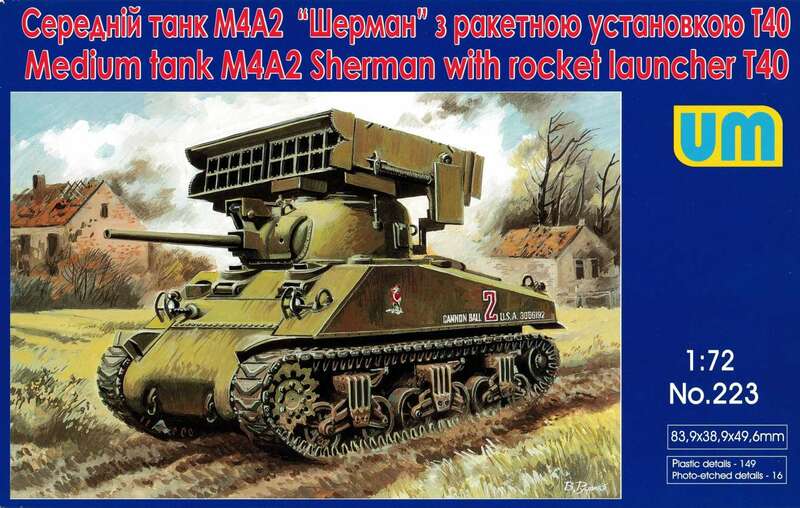 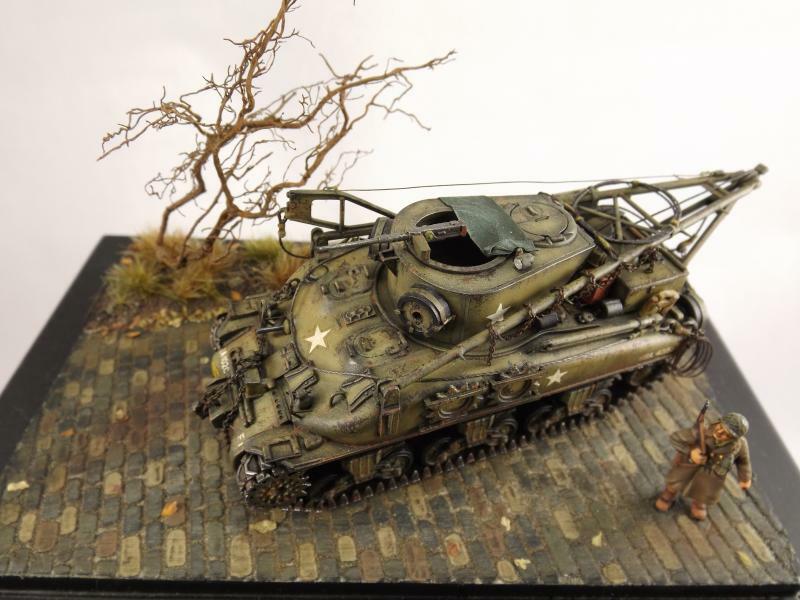 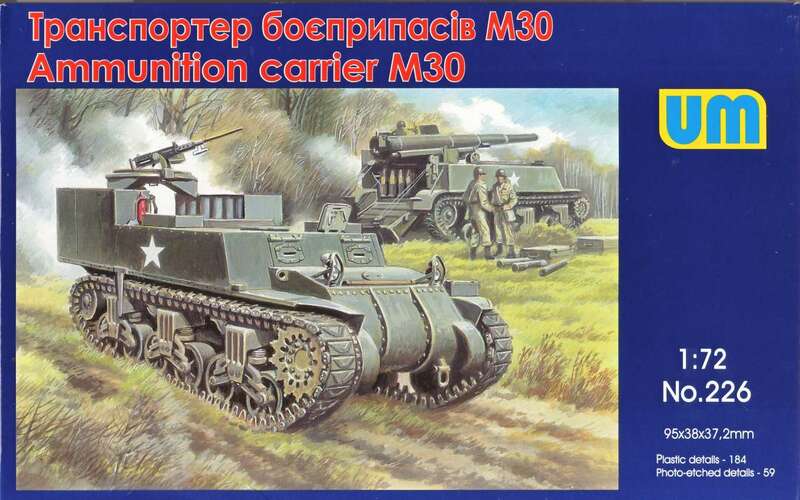 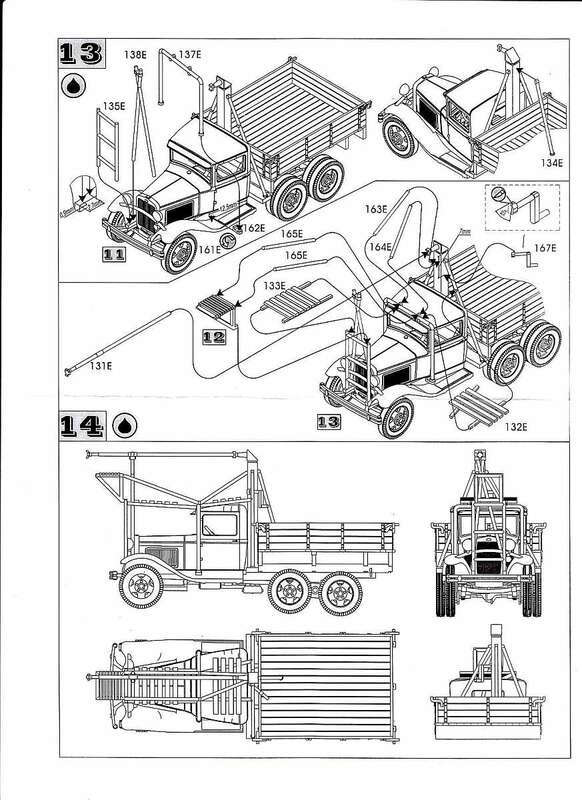 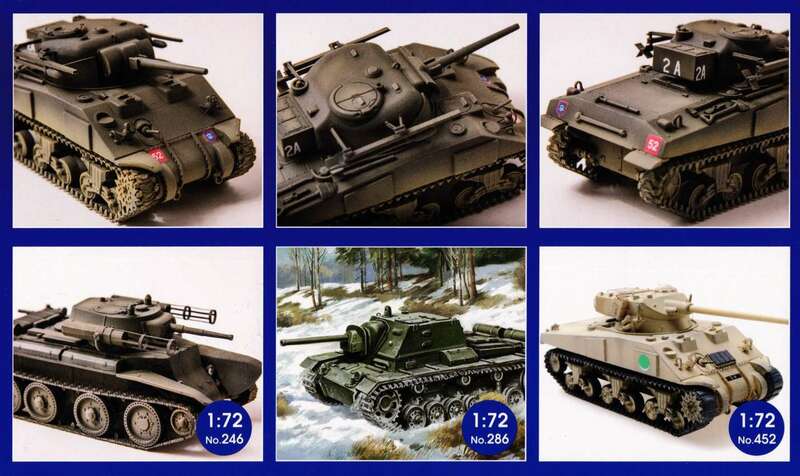 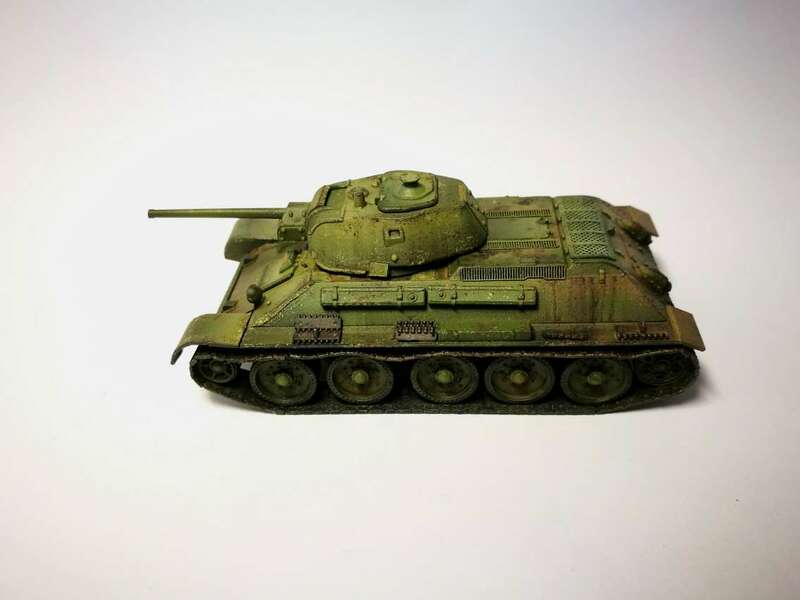 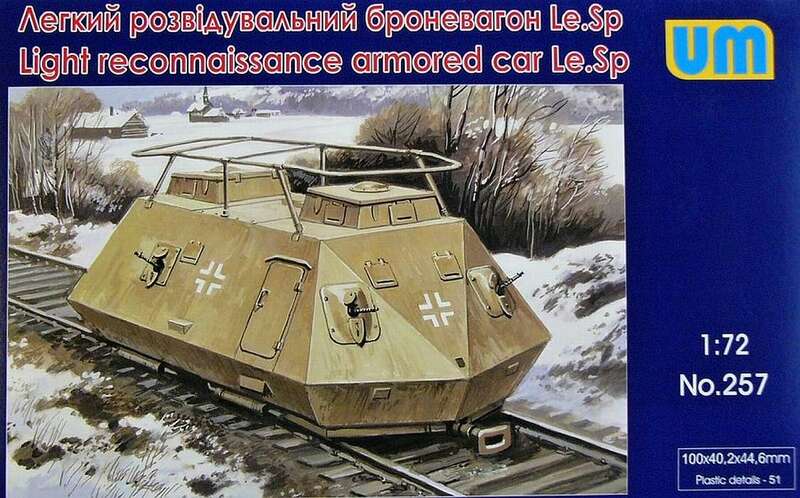 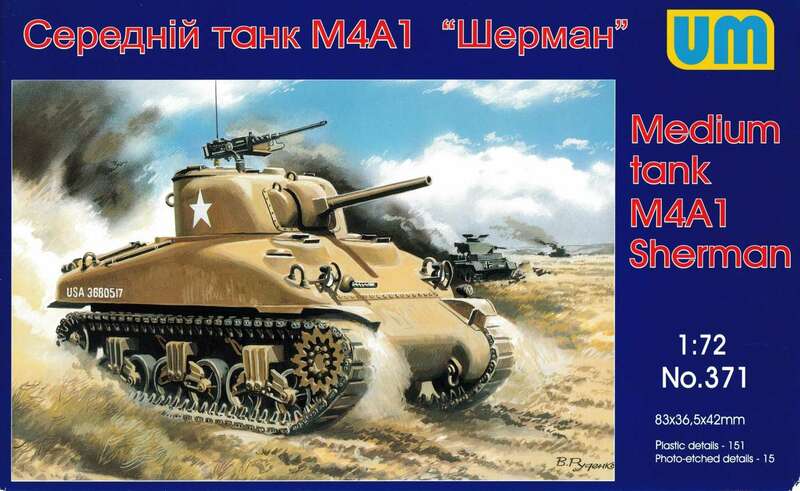 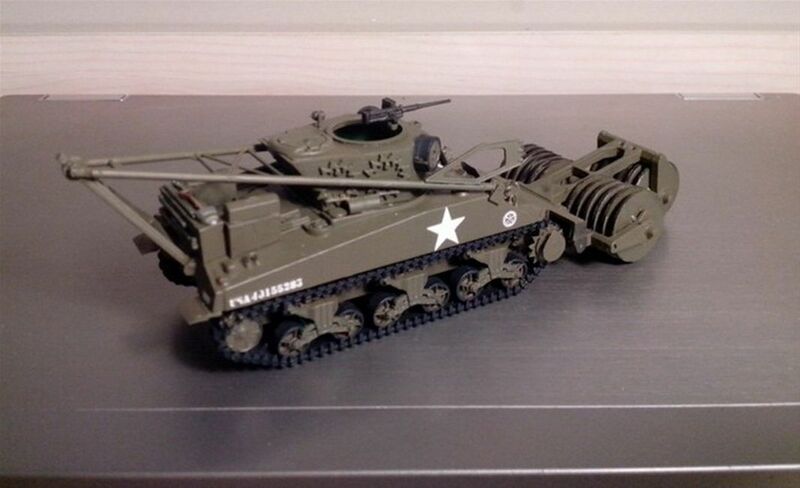 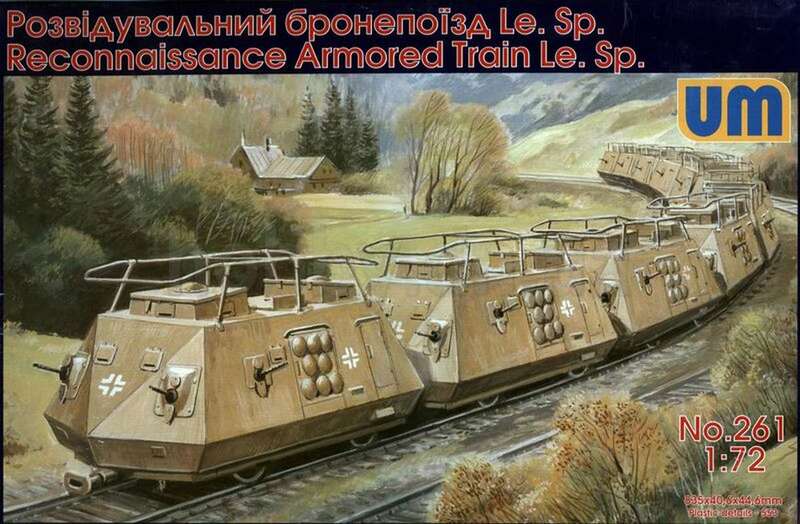 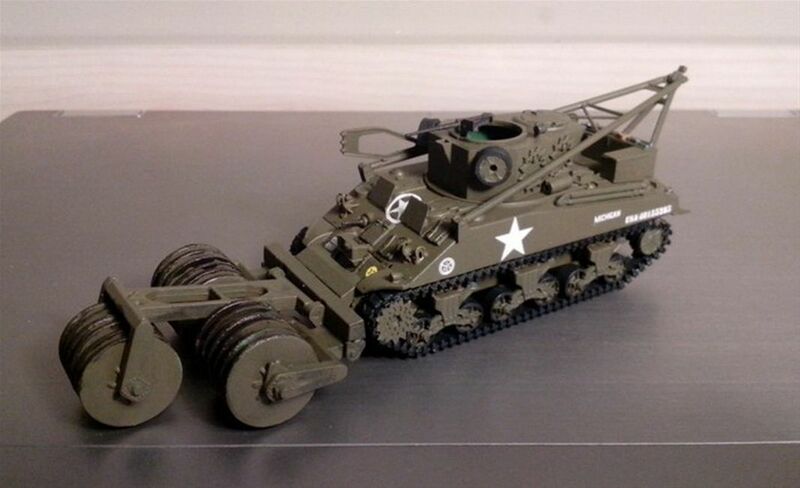 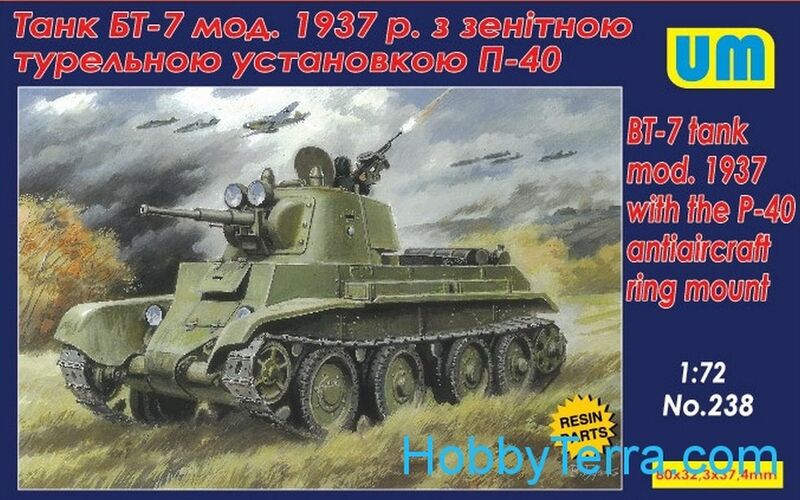 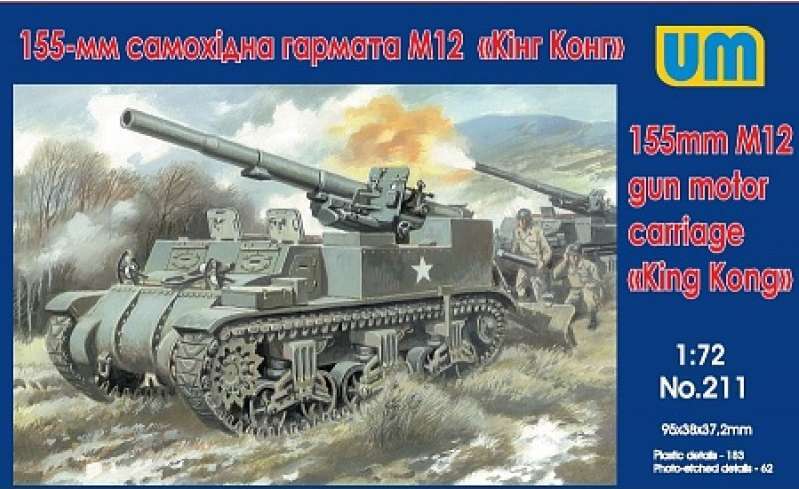 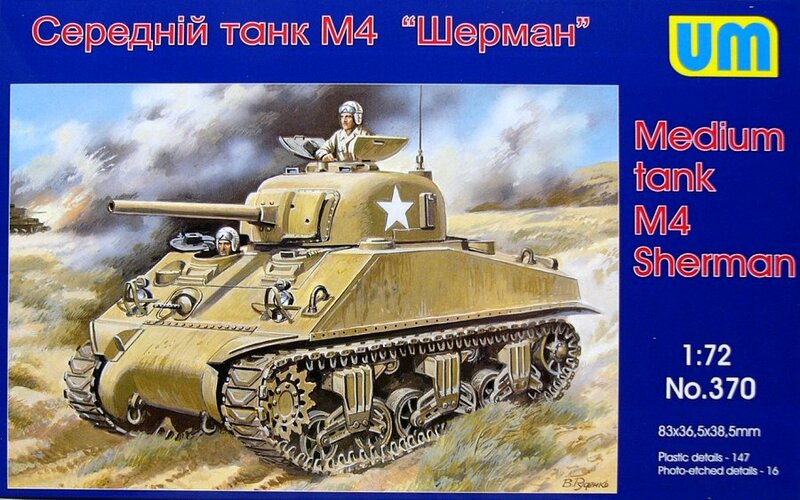 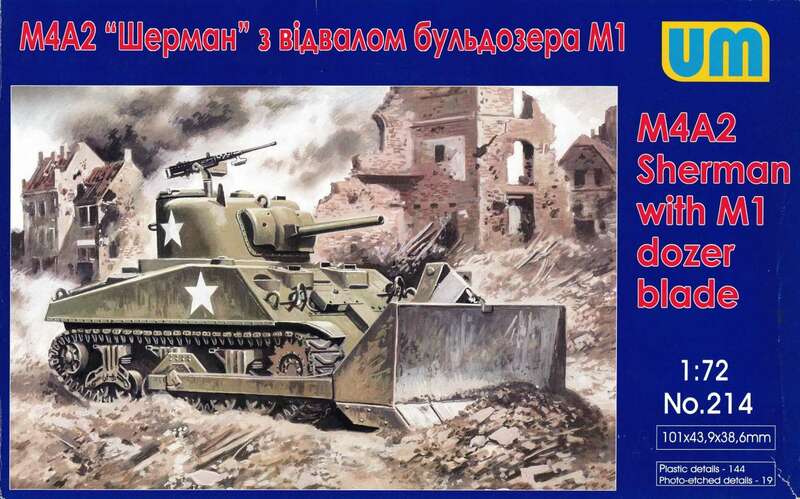 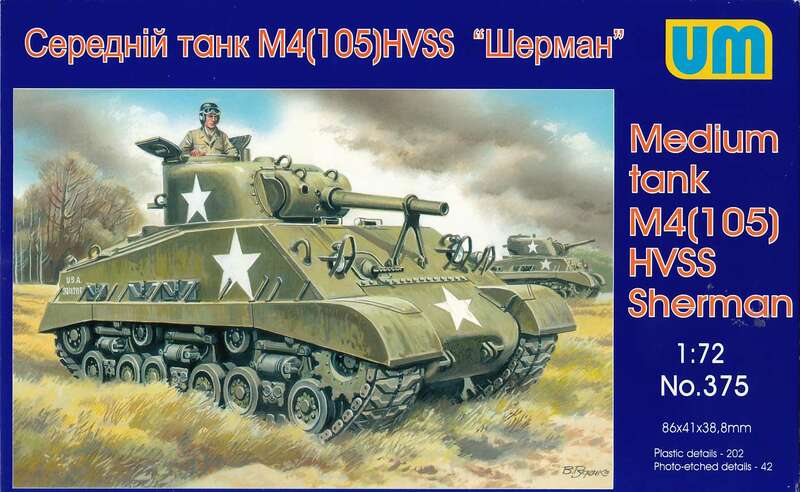 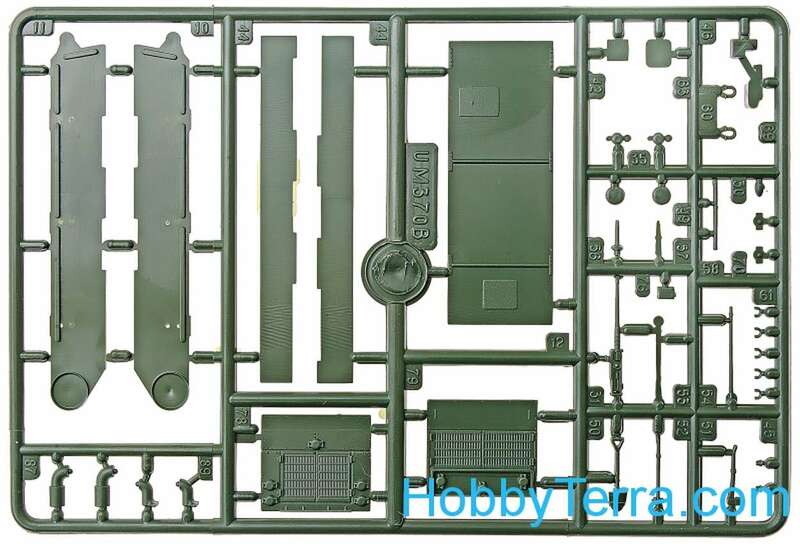 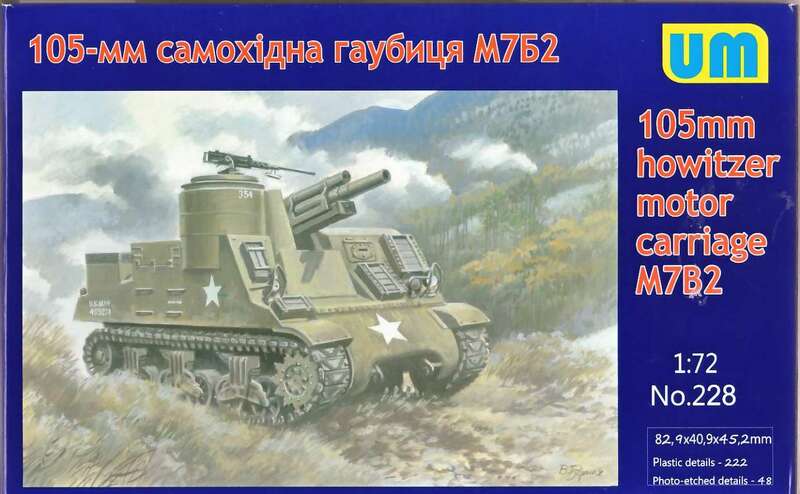 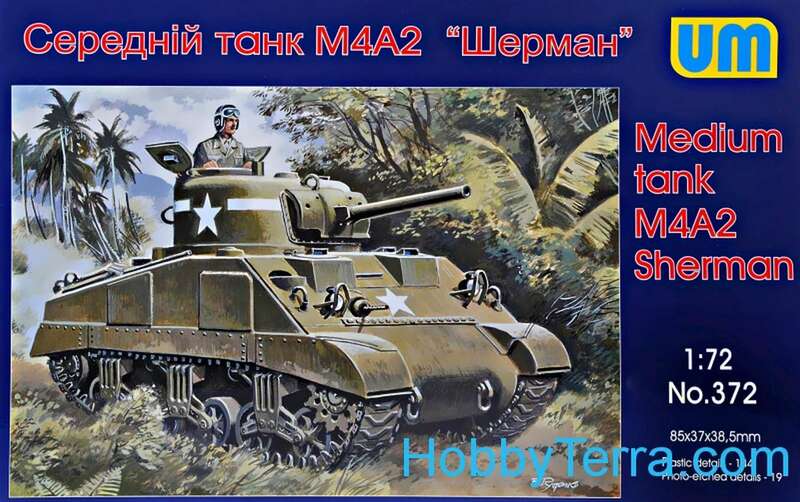 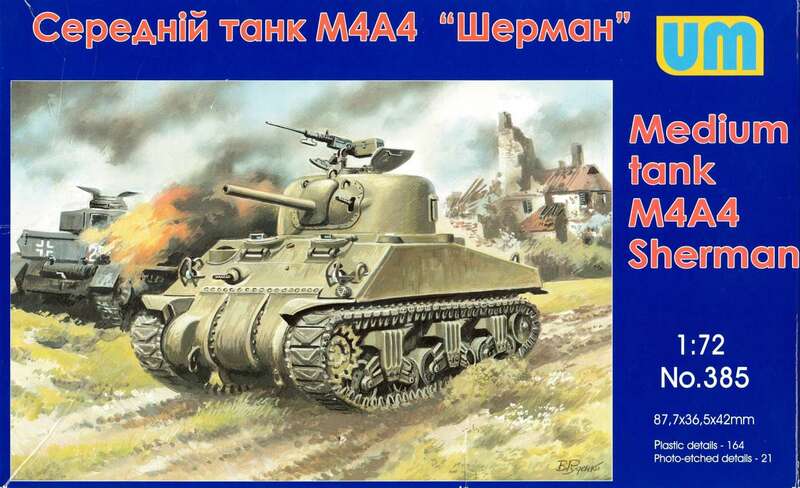 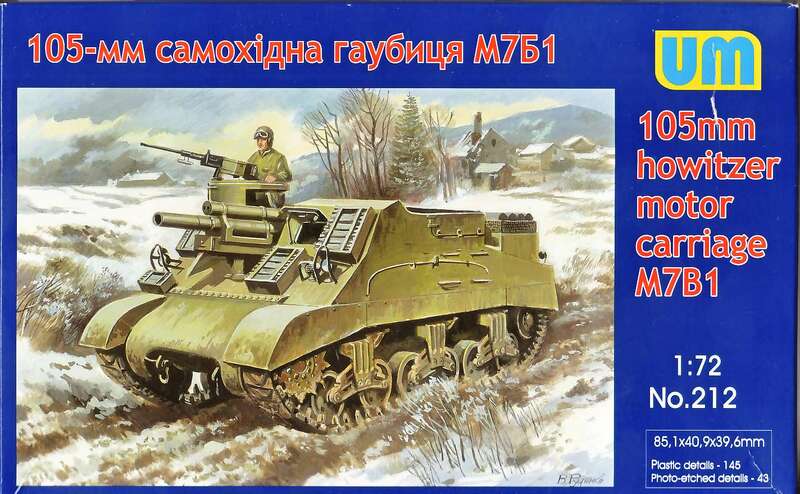 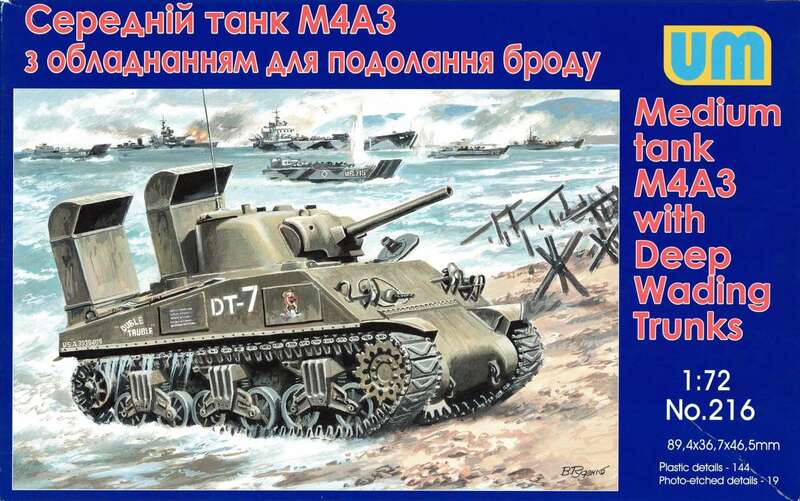 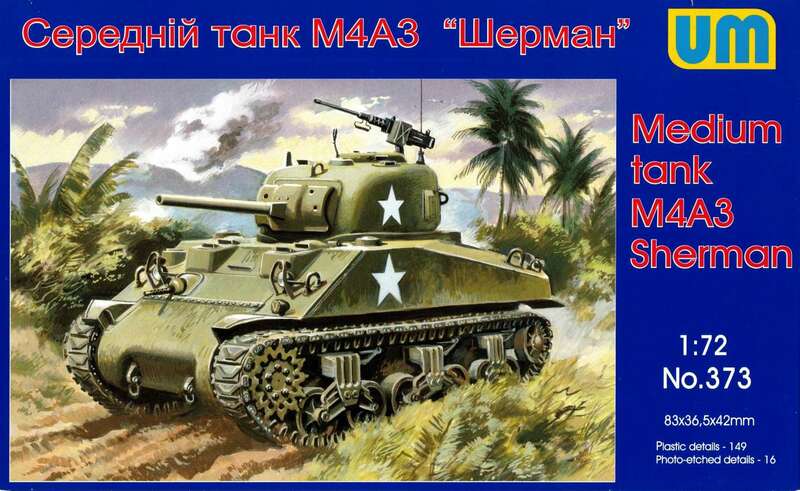 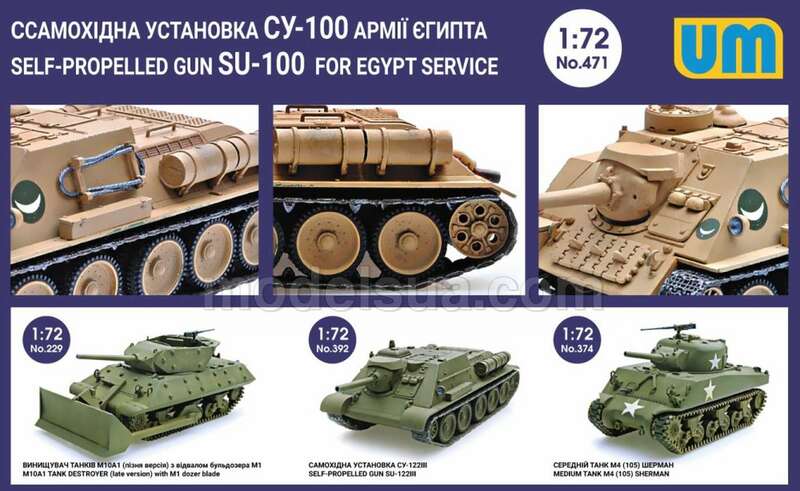 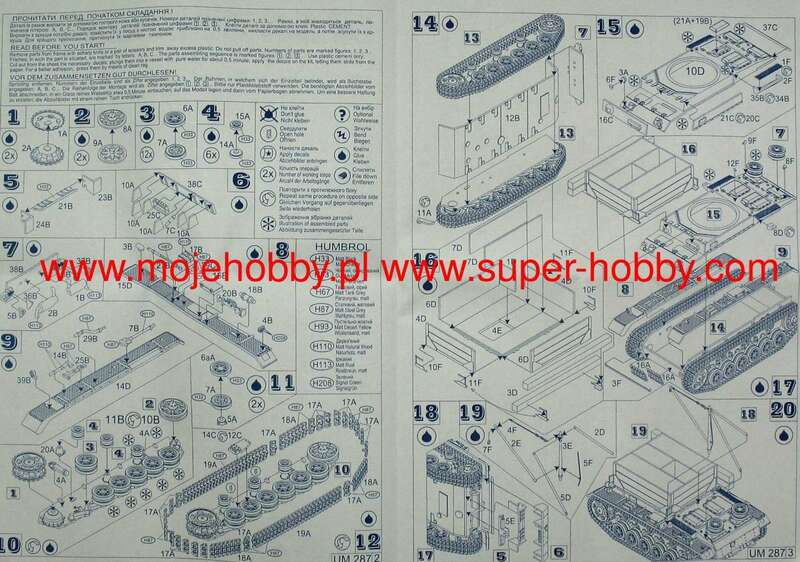 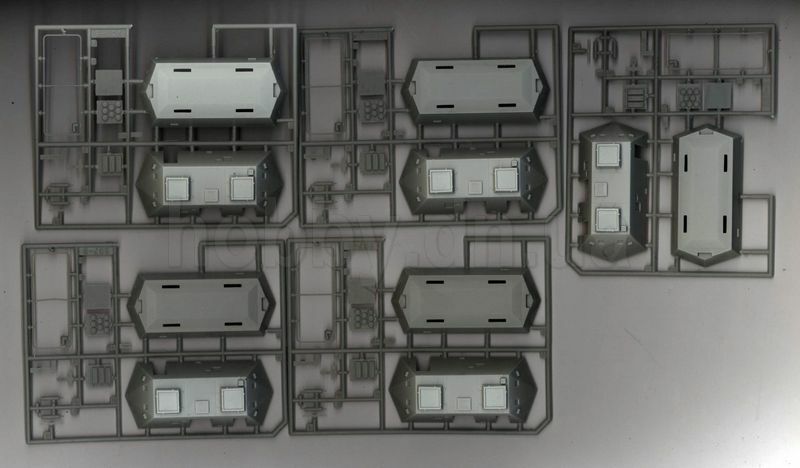 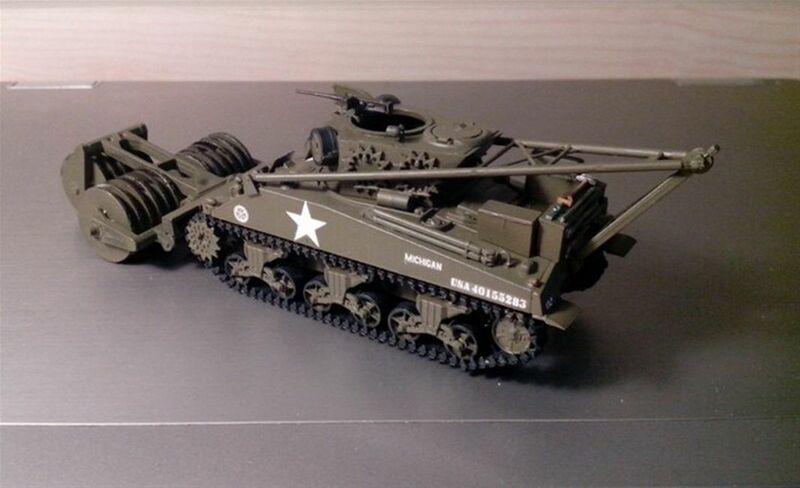 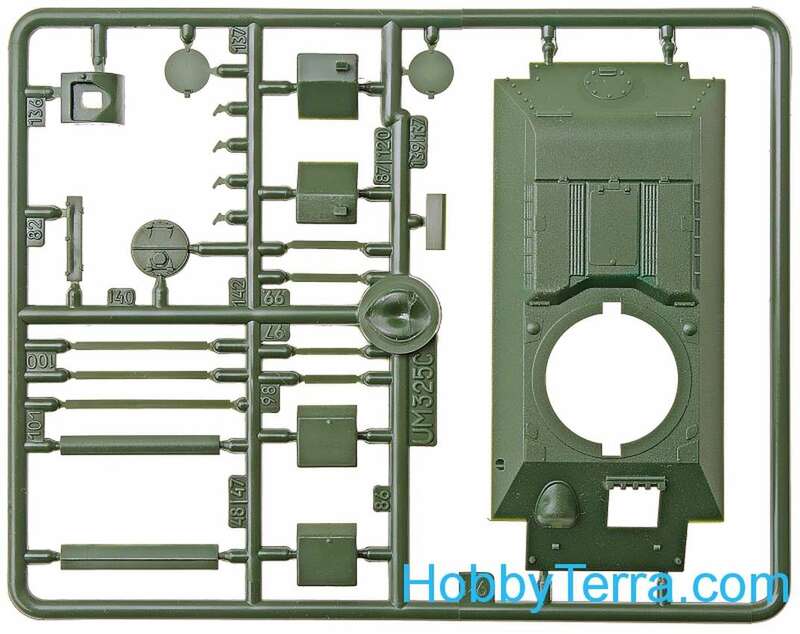 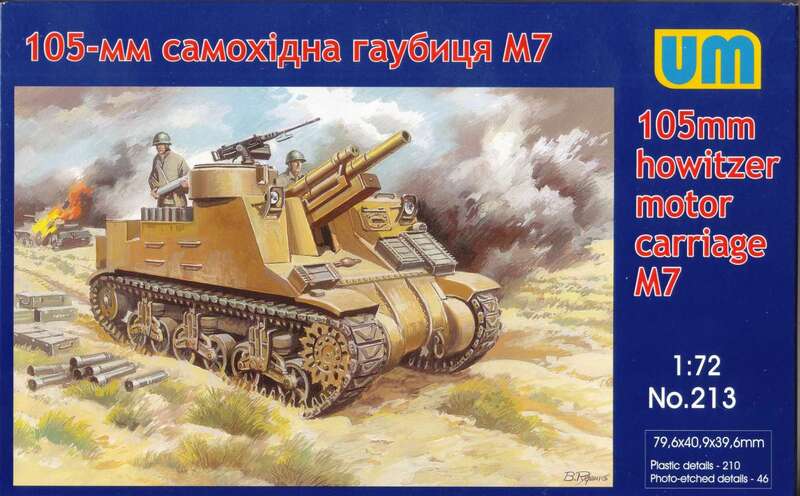 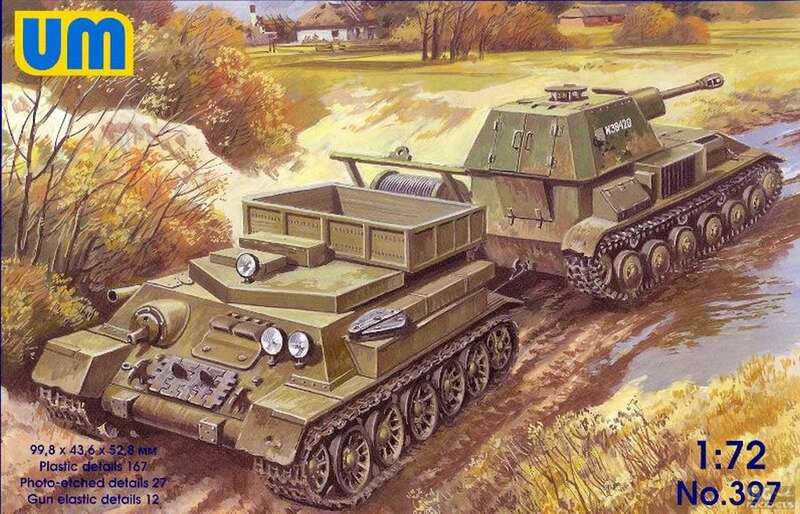 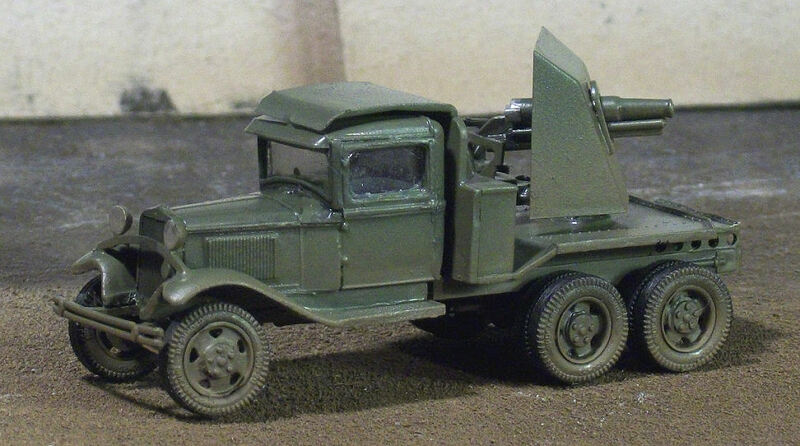 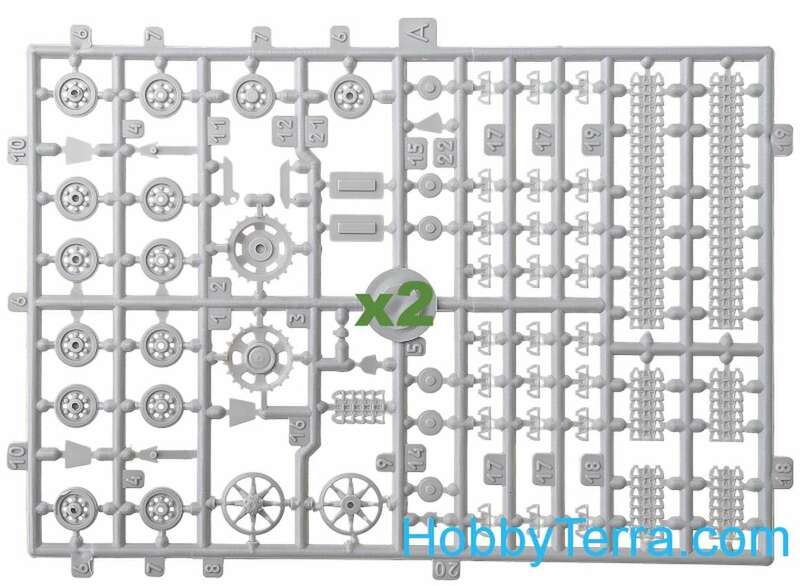 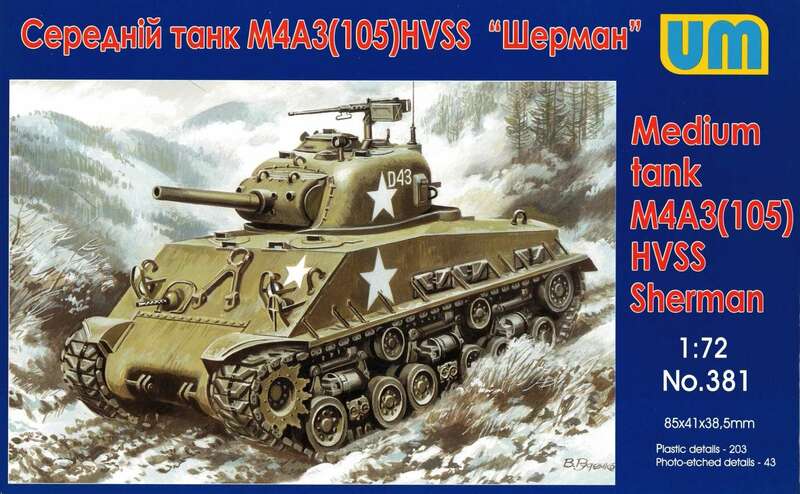 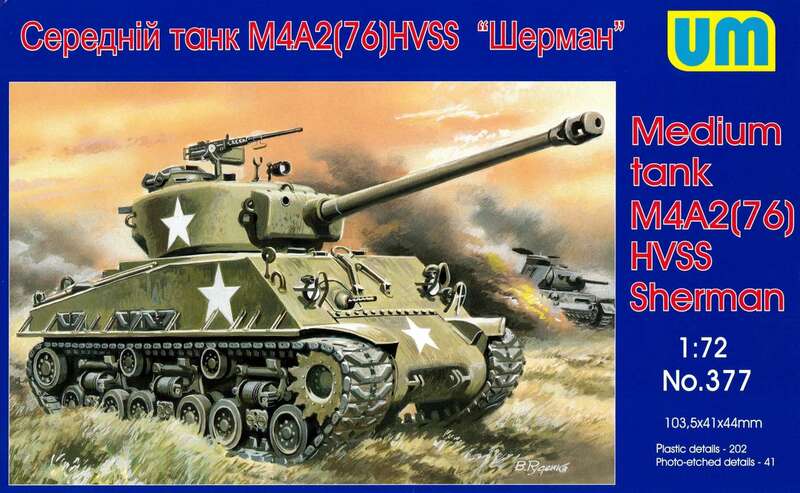 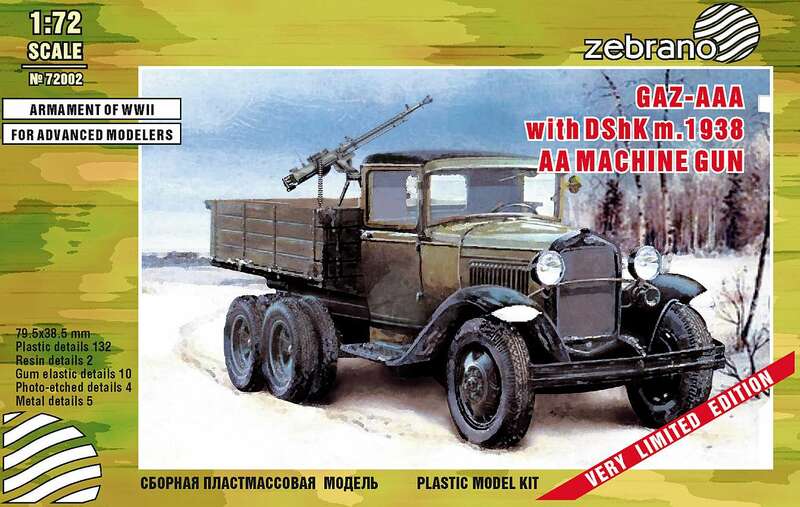 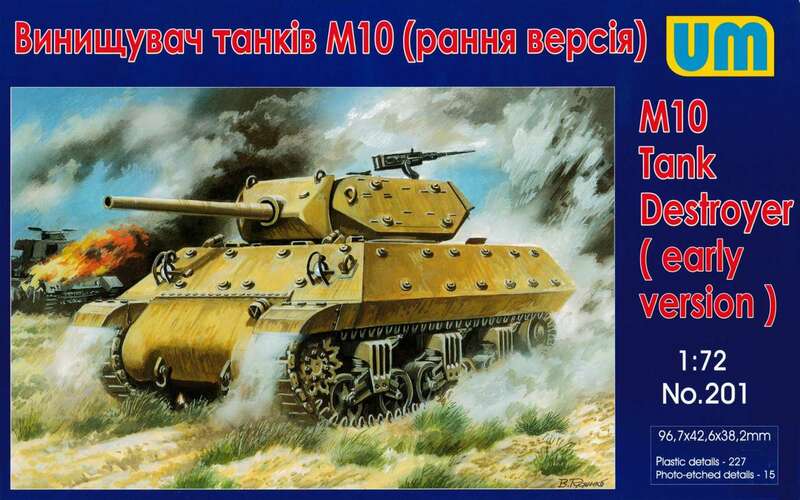 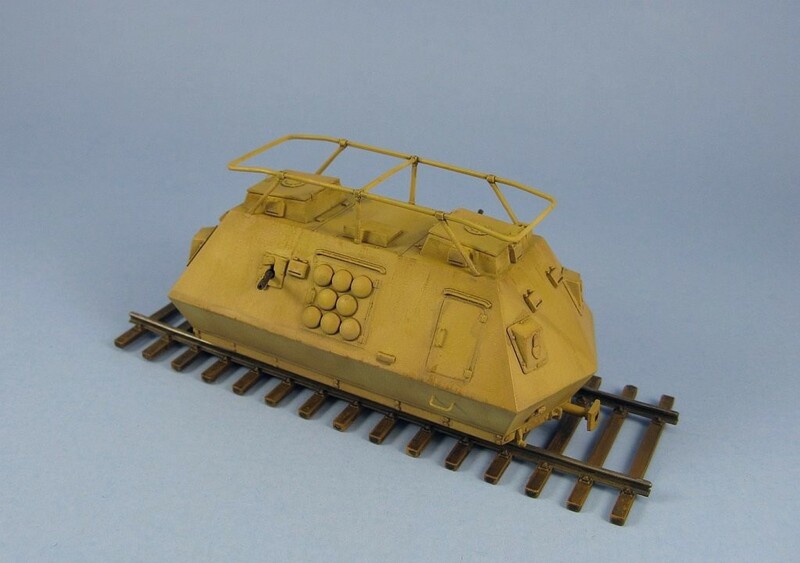 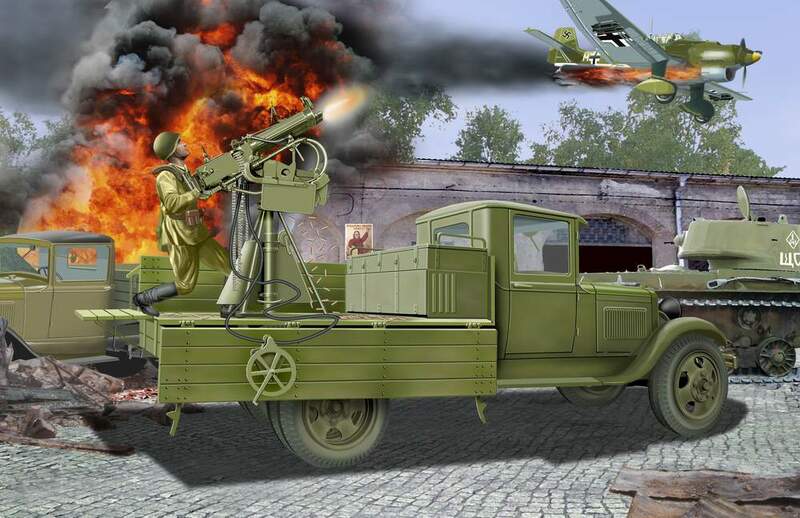 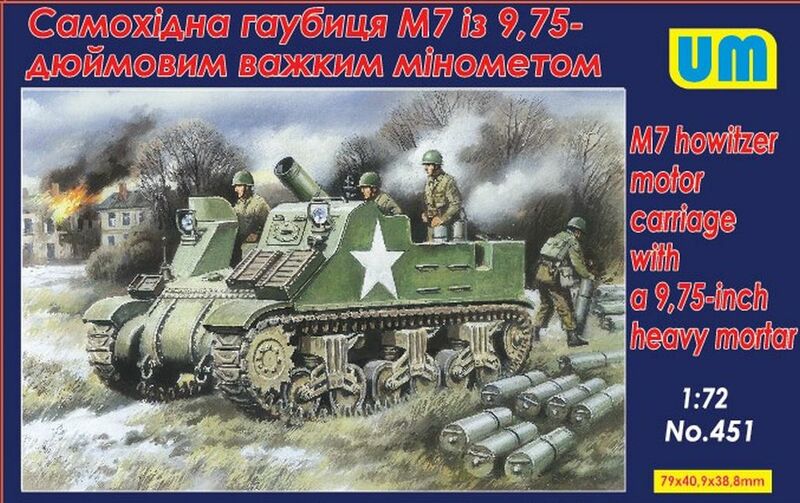 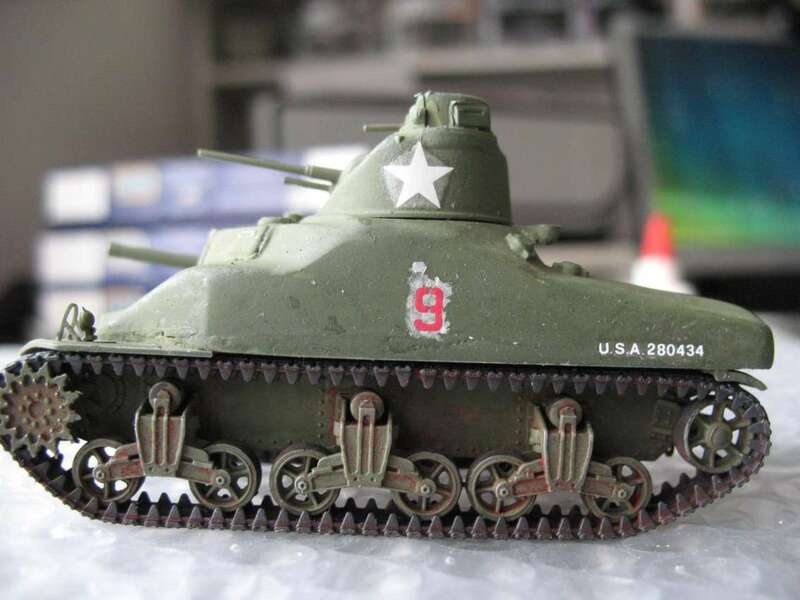 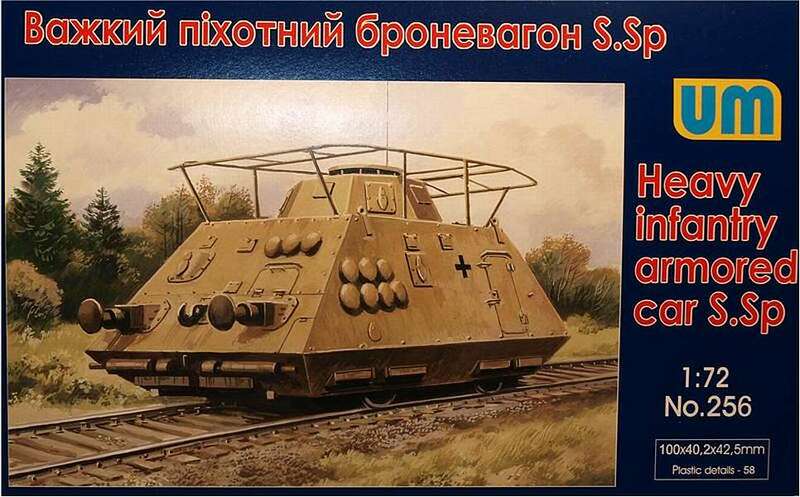 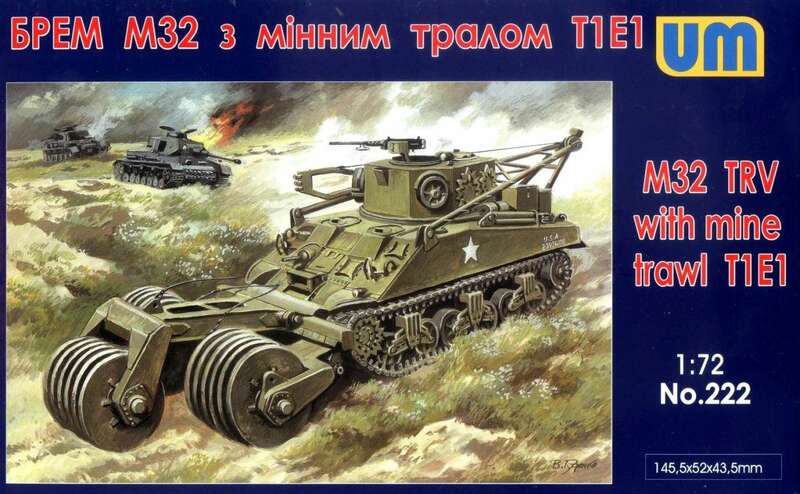 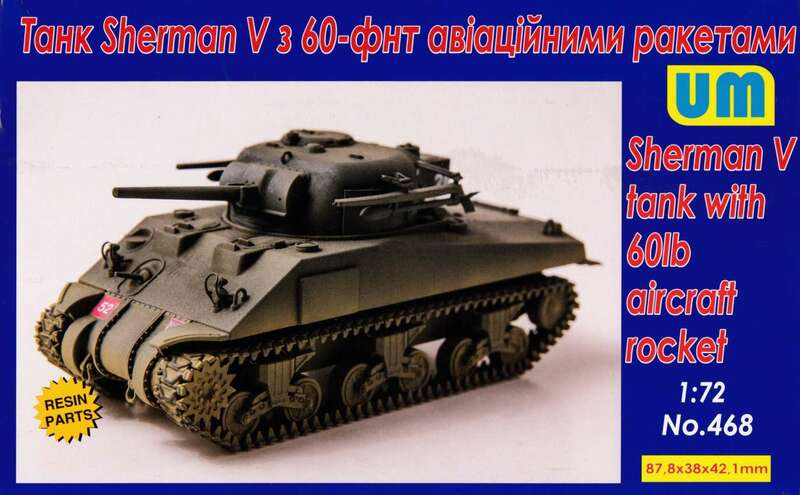 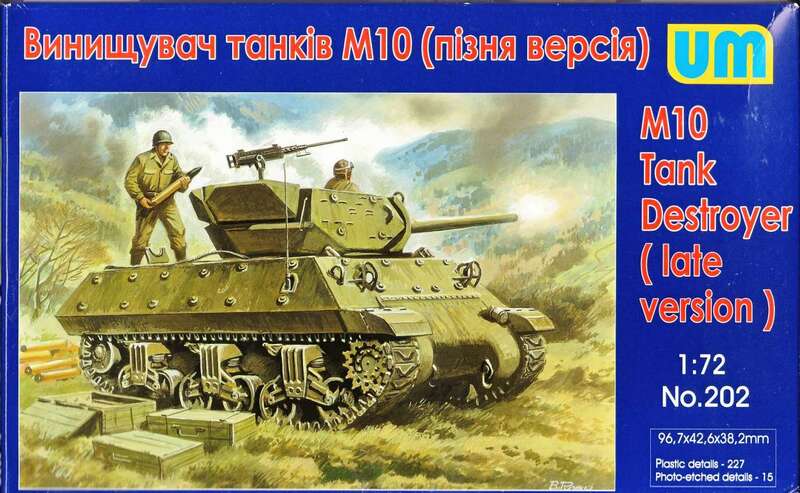 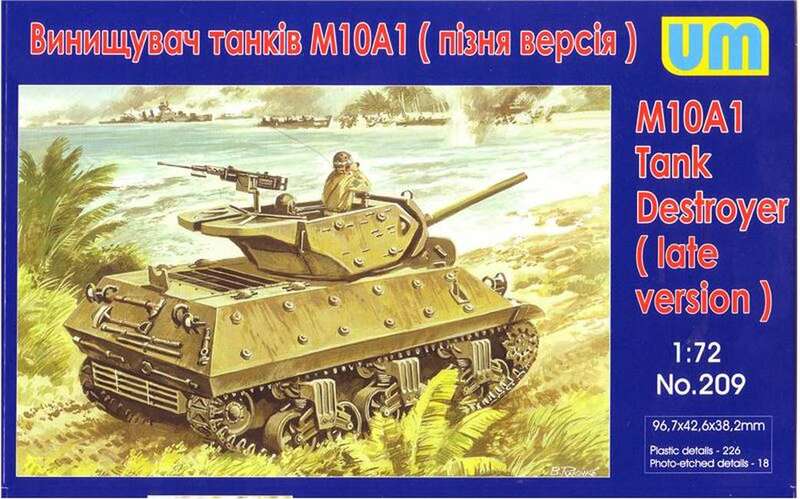 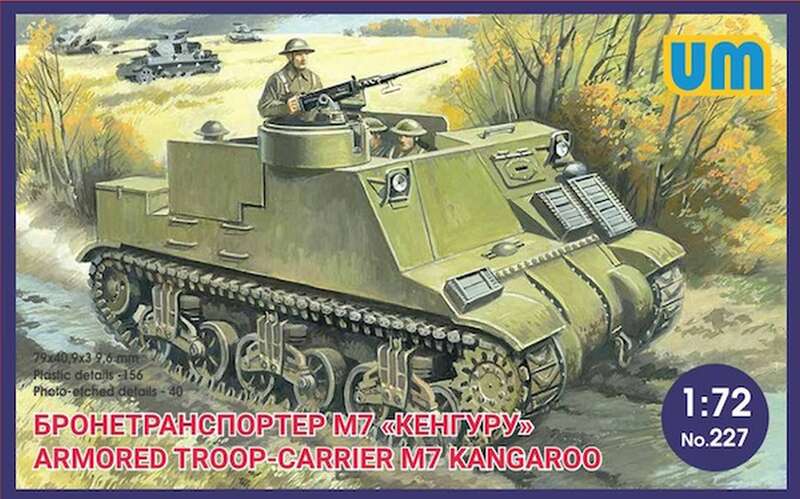 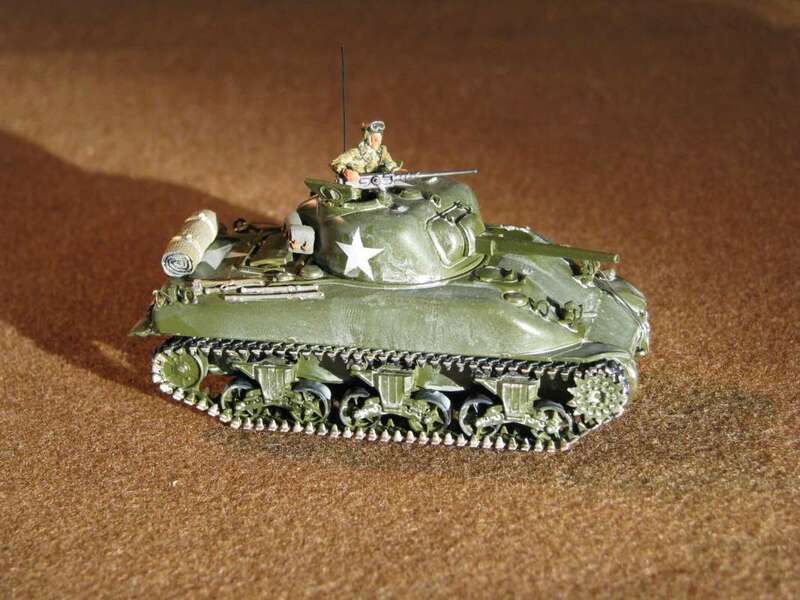 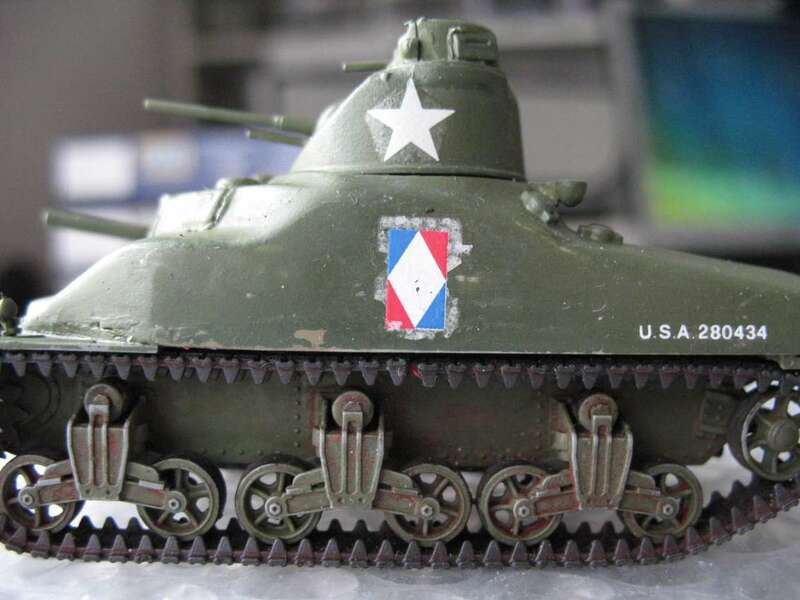 With the released M10 / M36 kits 201, 202, 205 and 206 you can made all variants of this vehicles. 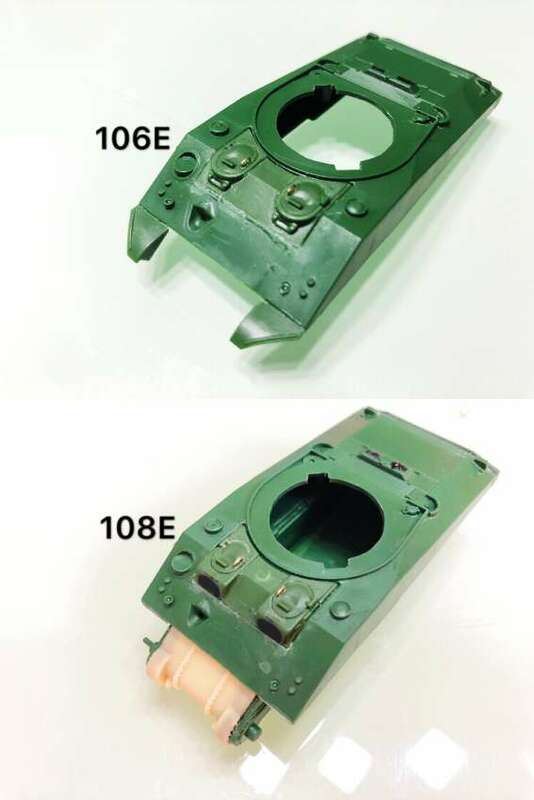 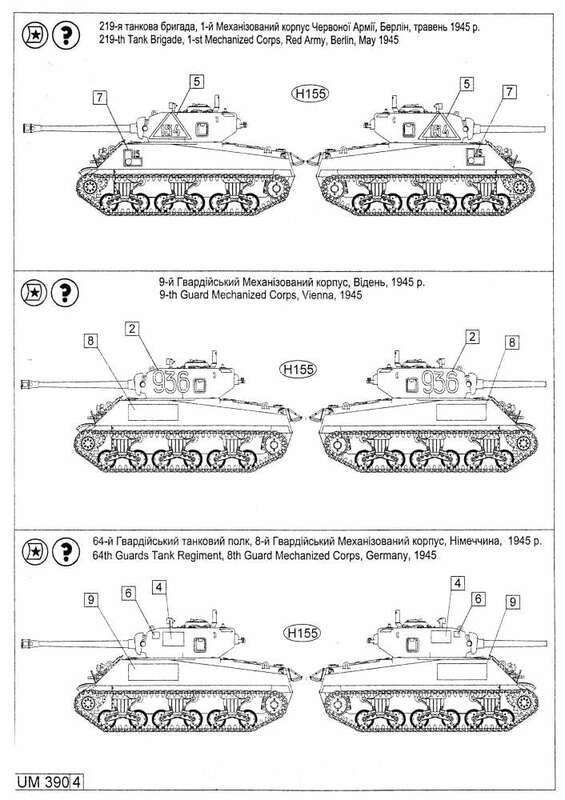 The hull of the M10 and the M36 are the same. 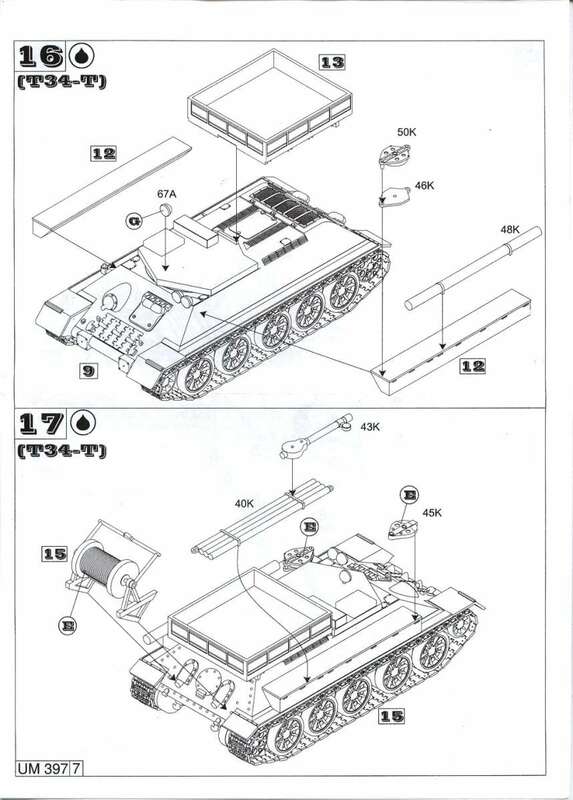 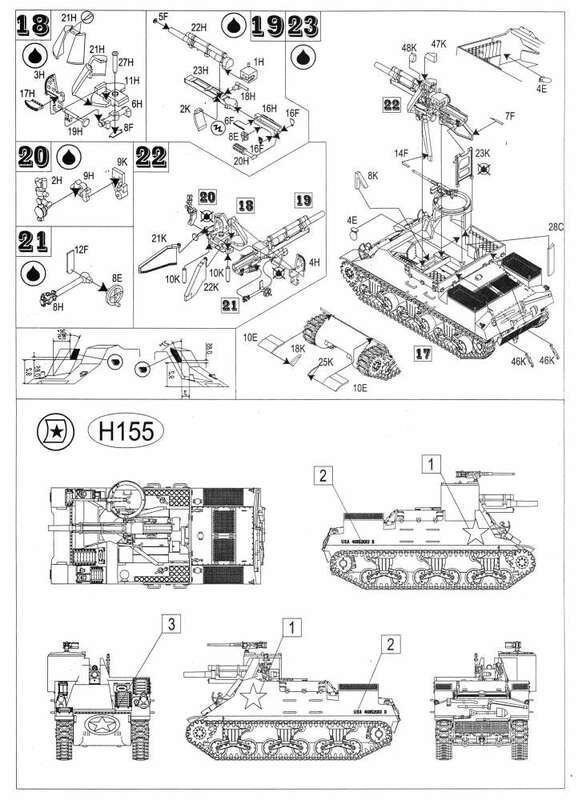 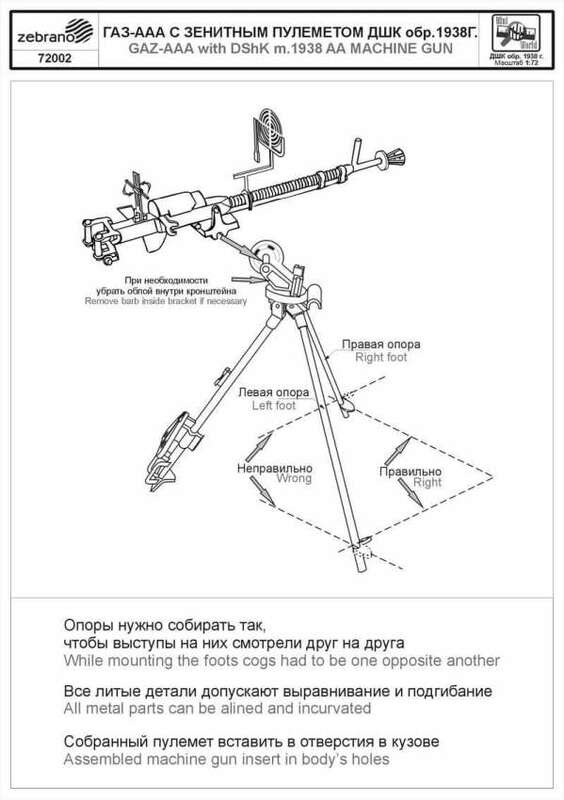 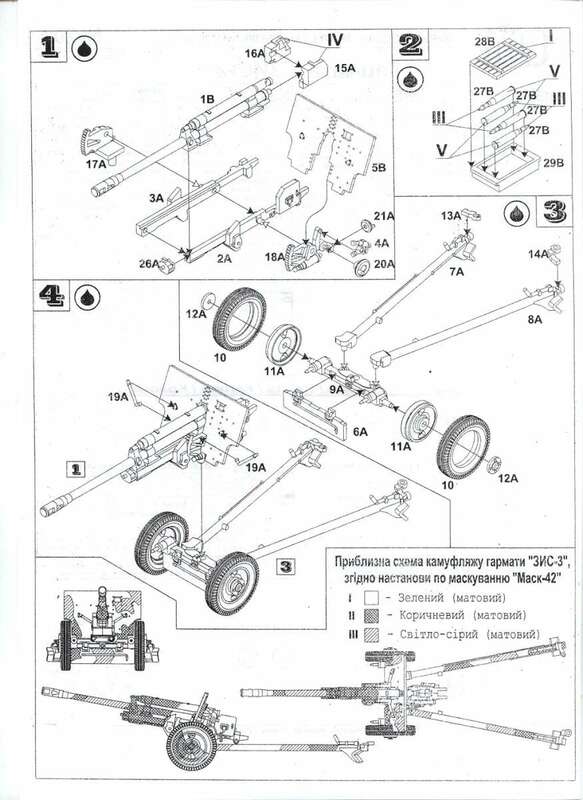 It's only need to exchange some parts as gun, turret and counterweight. 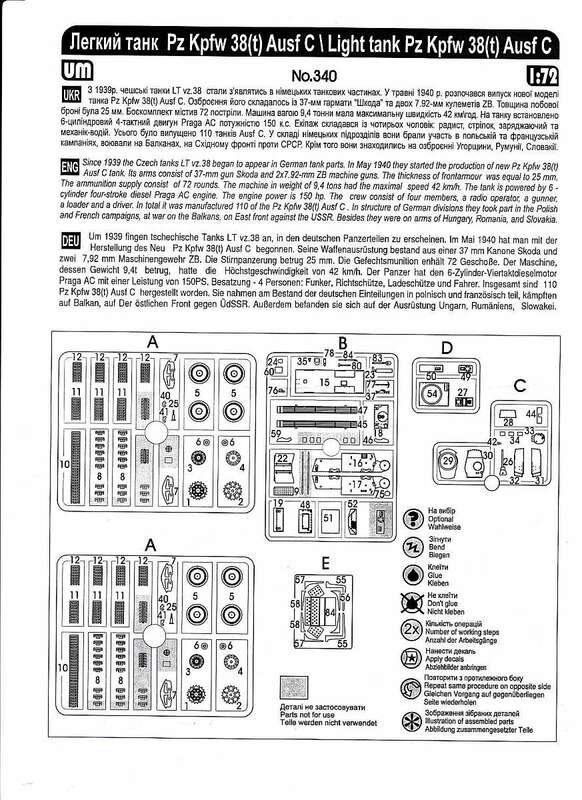 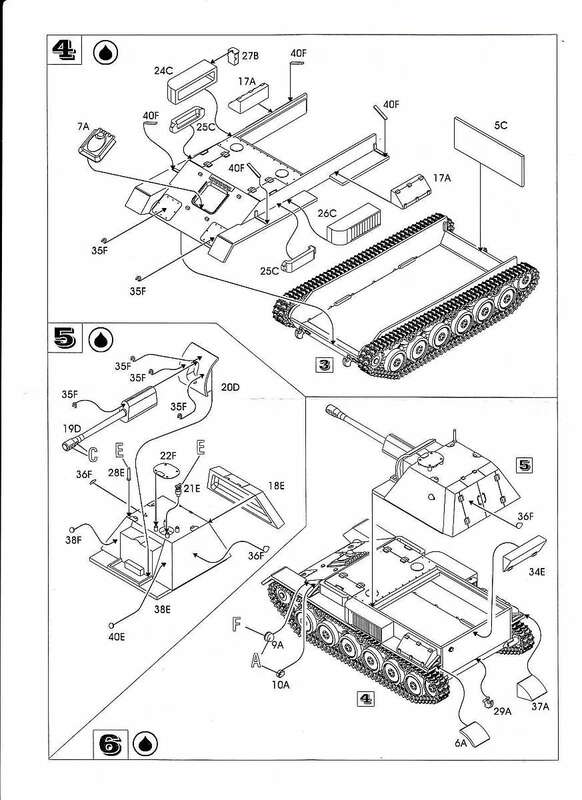 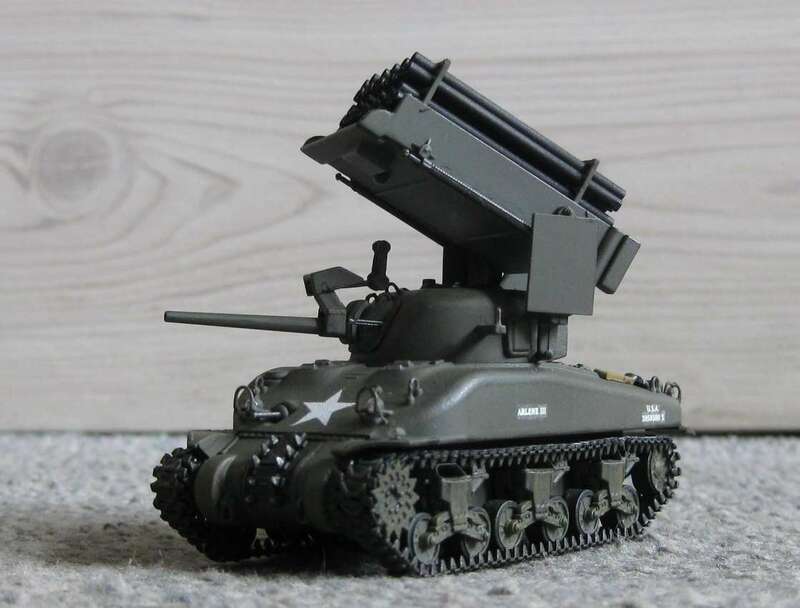 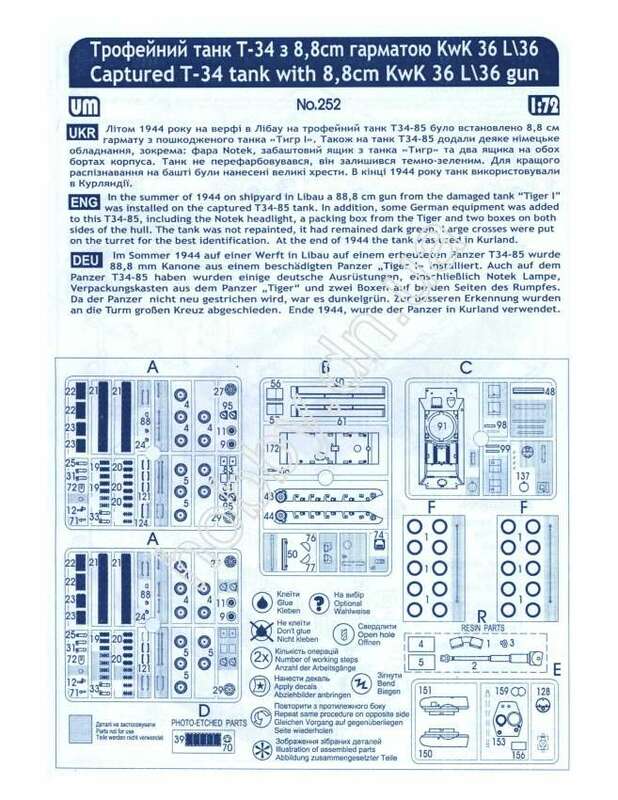 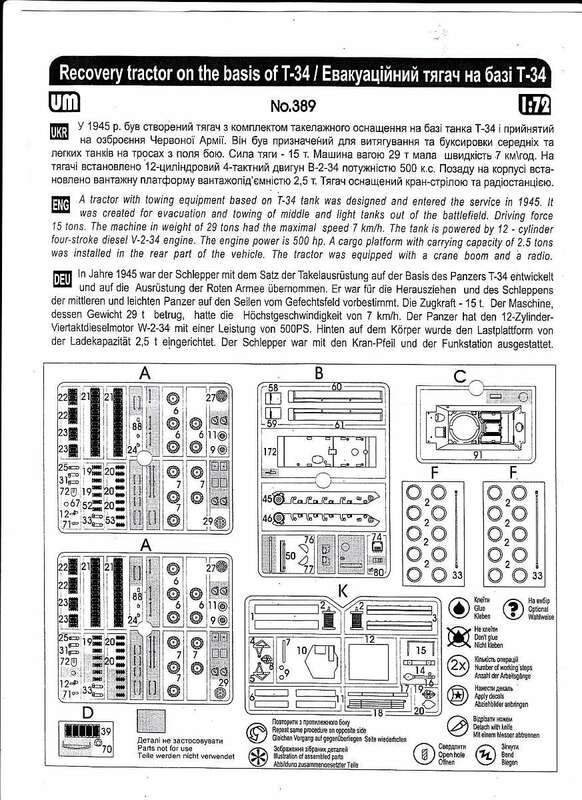 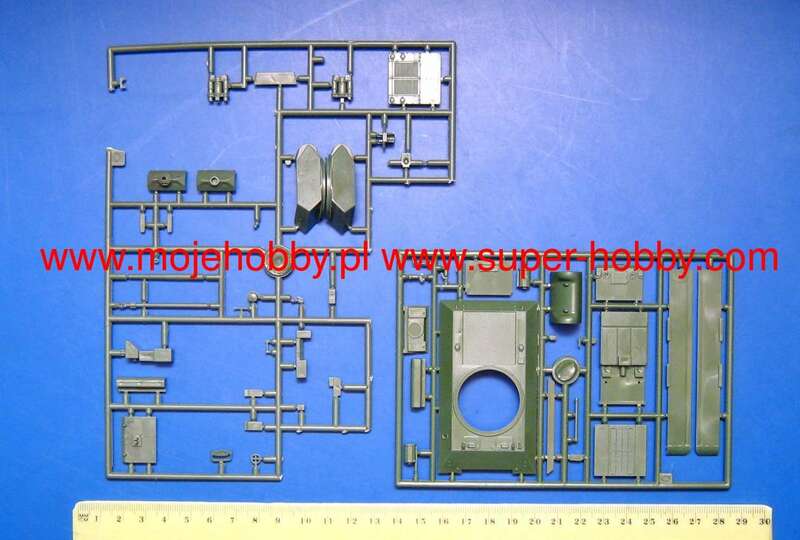 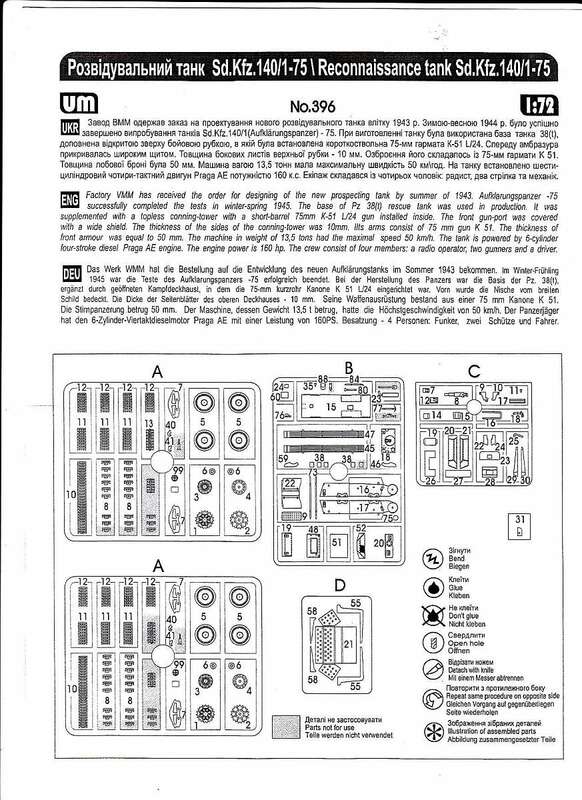 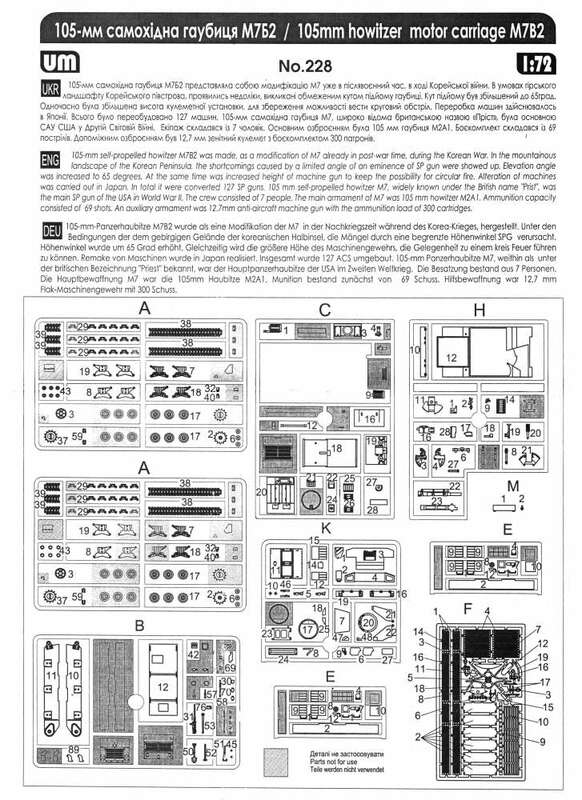 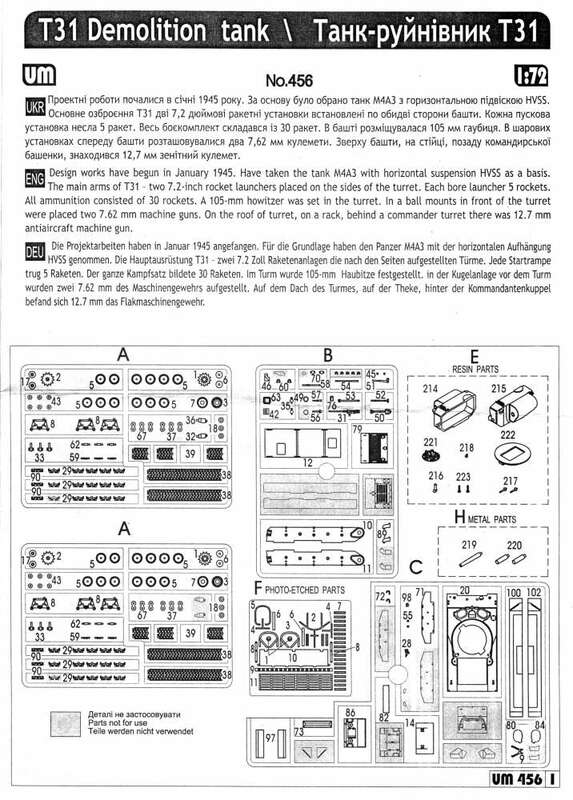 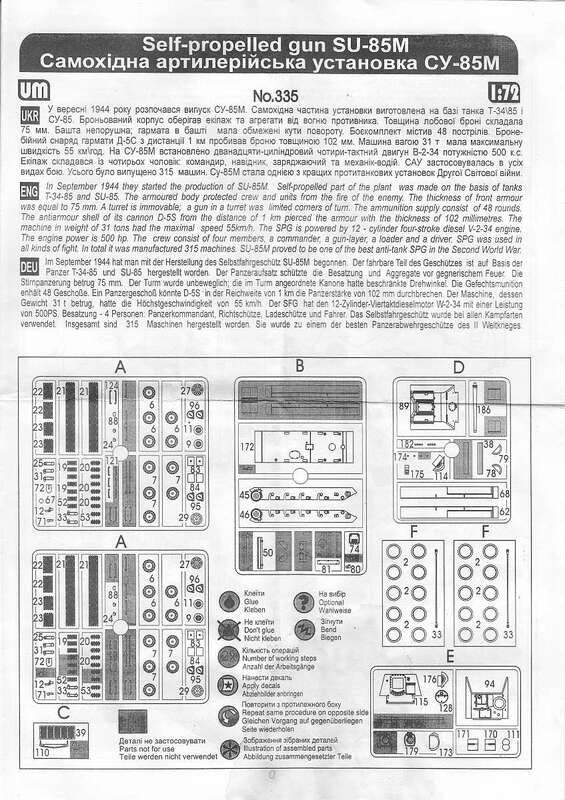 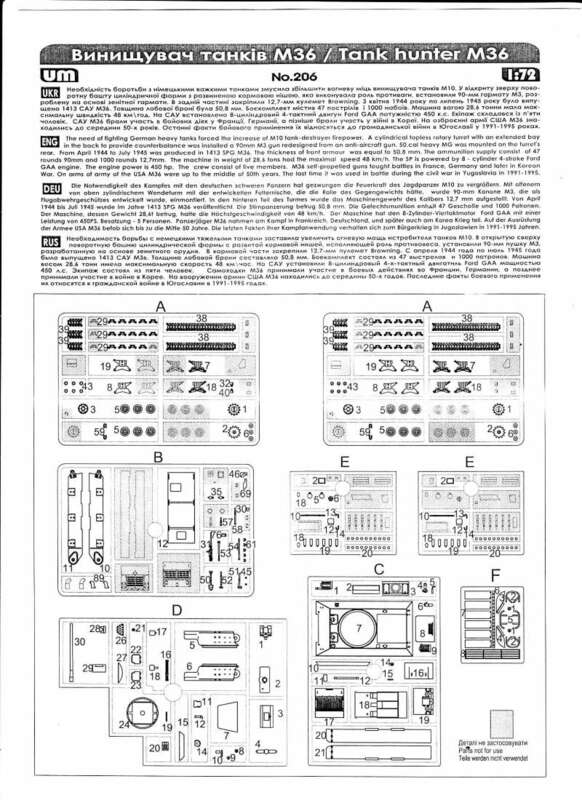 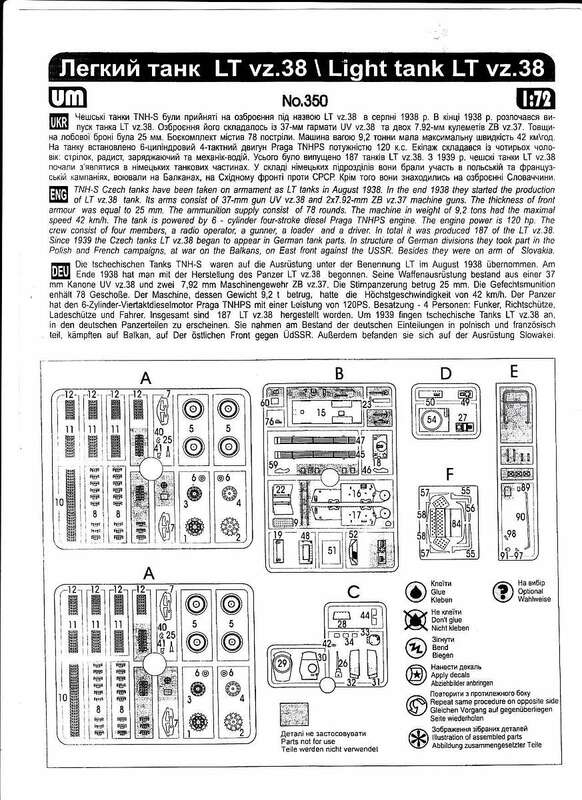 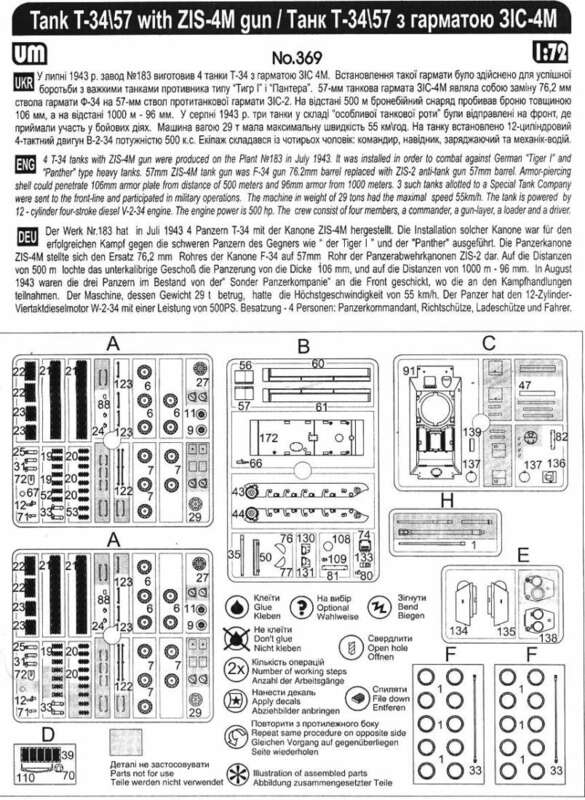 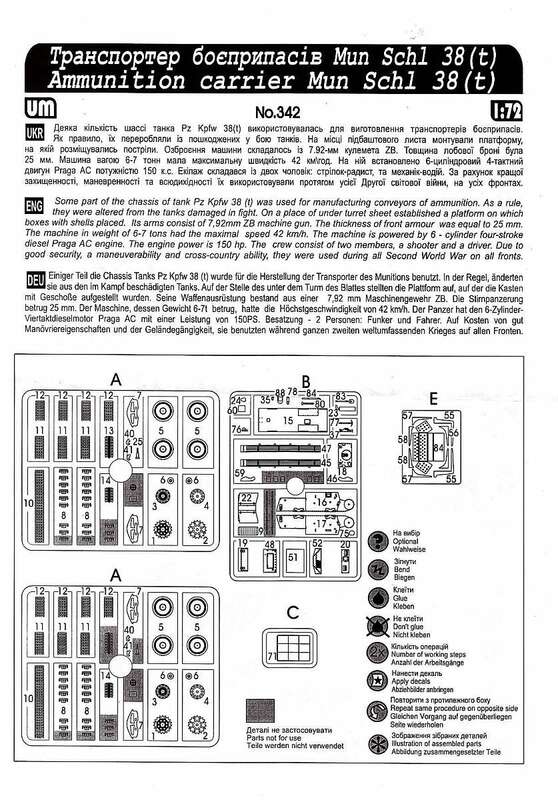 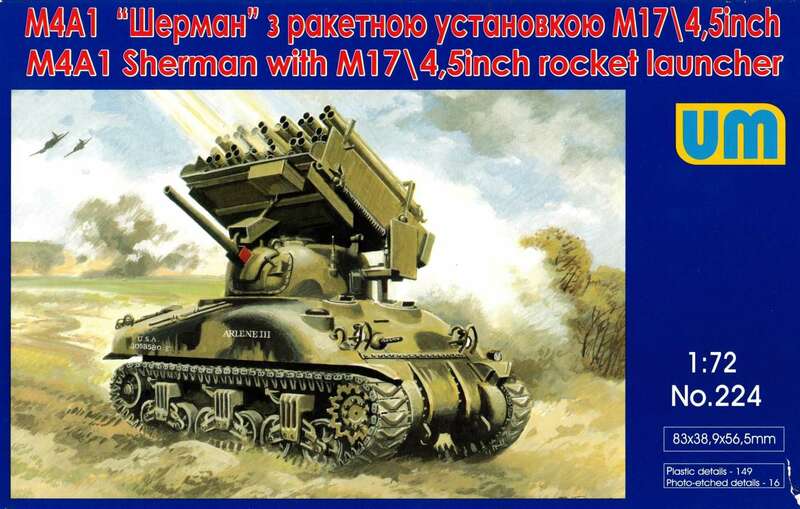 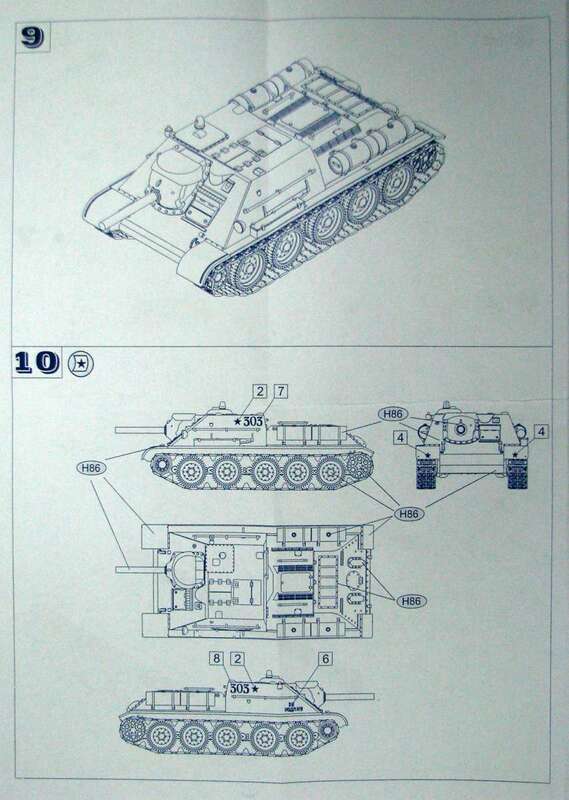 Also the patrol engine version M10A1 possible by echange the engine deck. 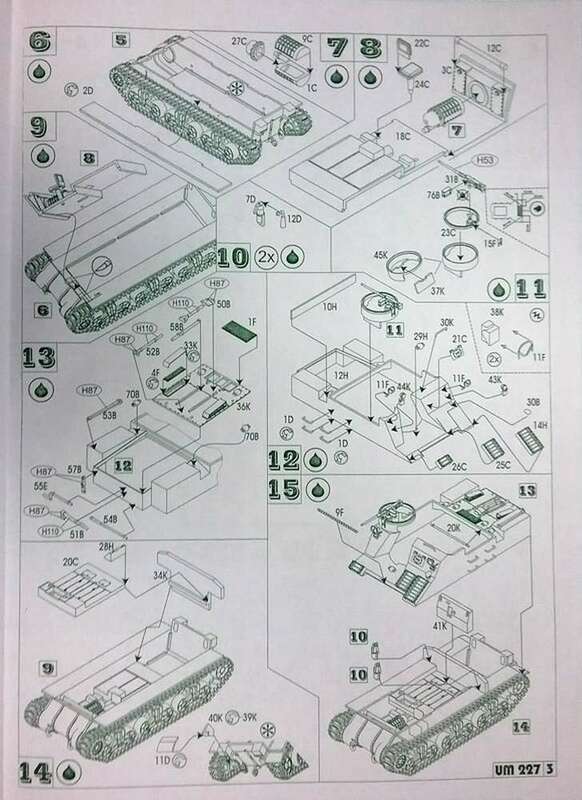 All needed parts are in the boxes. 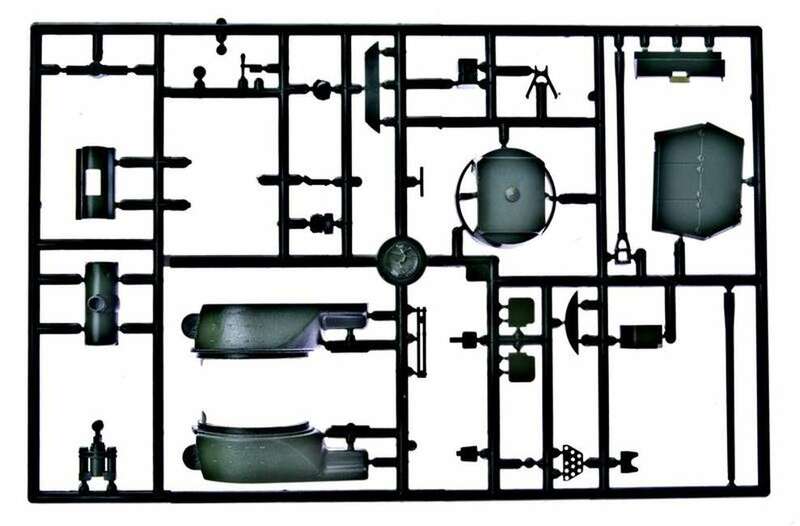 Kit 206 - M36 Tankdestroyer "Jackson"
The engine of the Sherman "Aunt Jemina" variant was too week and had a pusher plate fitted at the rear for a second Sherman. 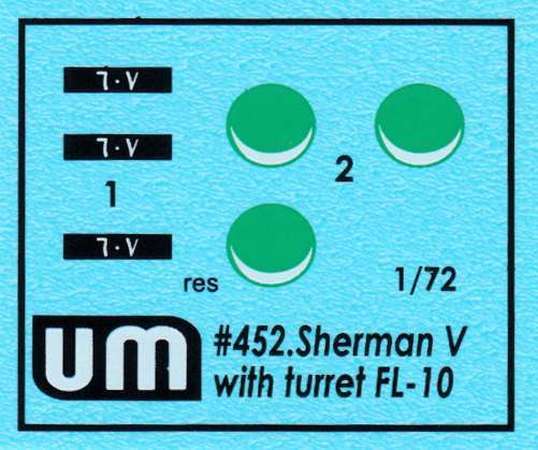 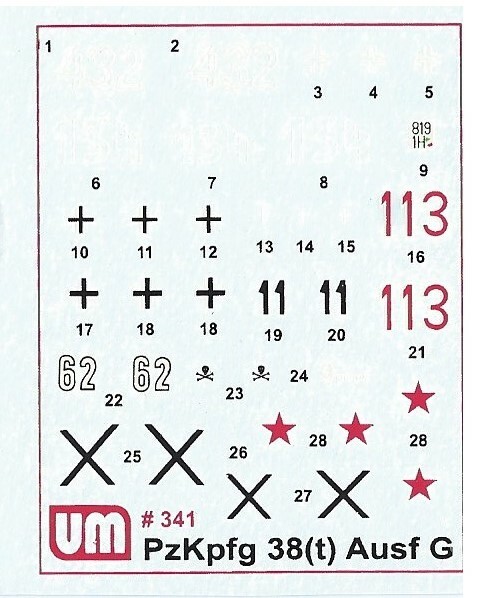 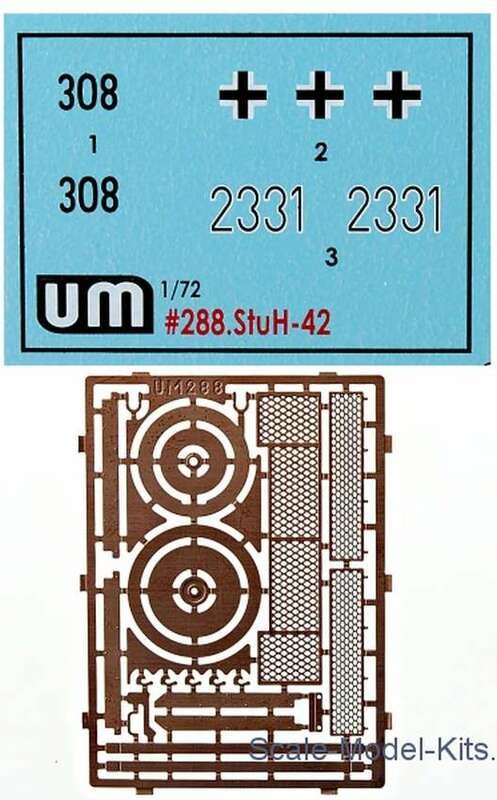 It seems that the pusher plate is missing on the UM-Model. 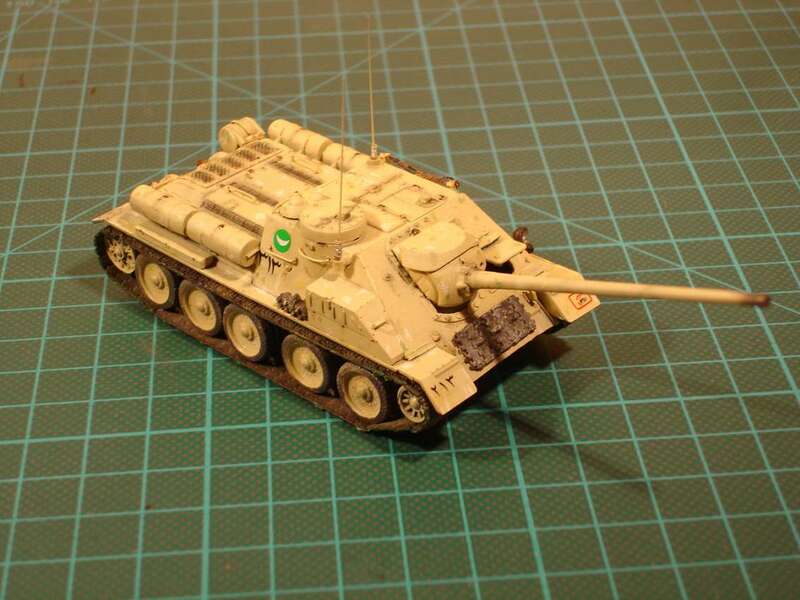 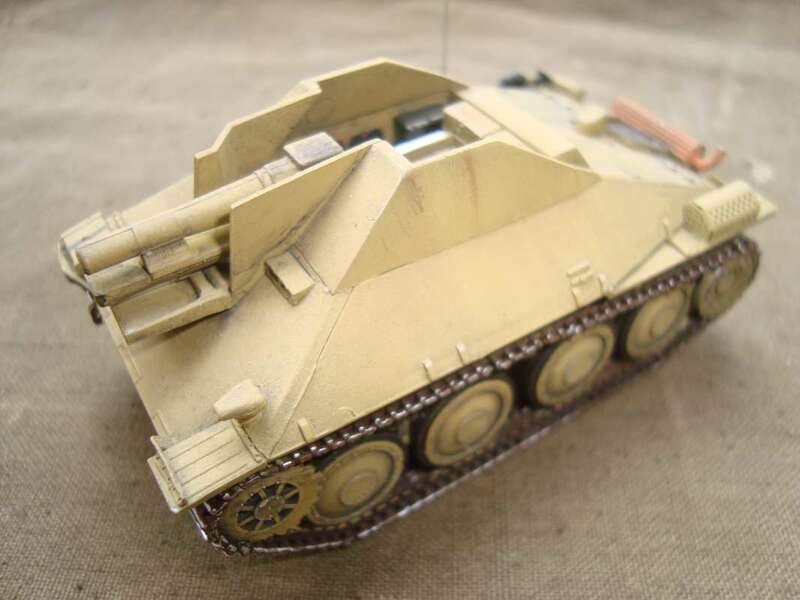 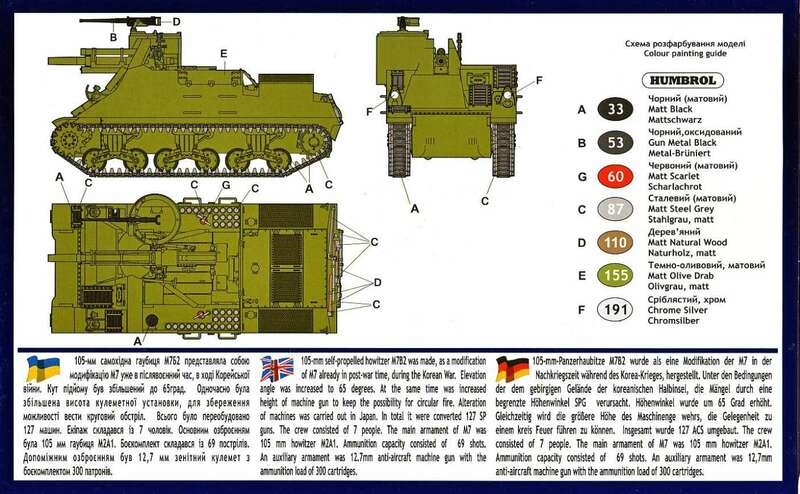 Kit 227 - M7 APC "Kangaroo"
The LT(Light Tank) vz. 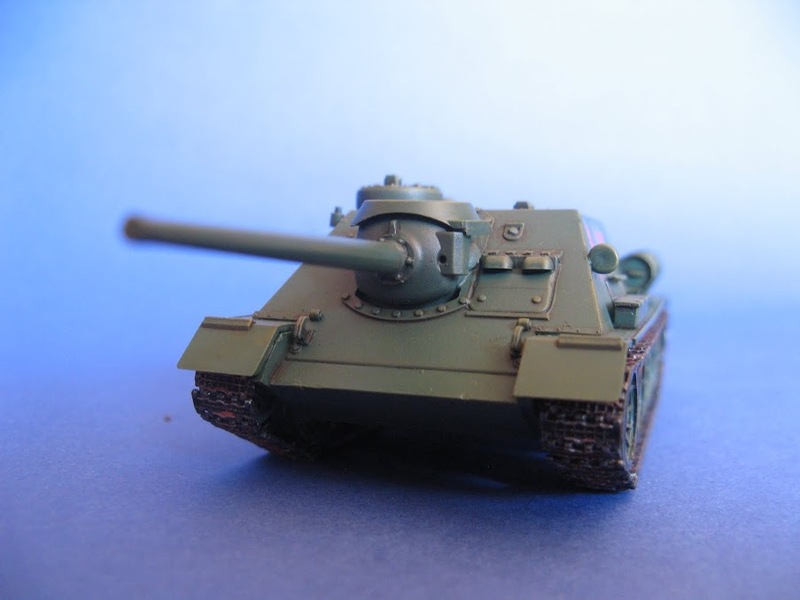 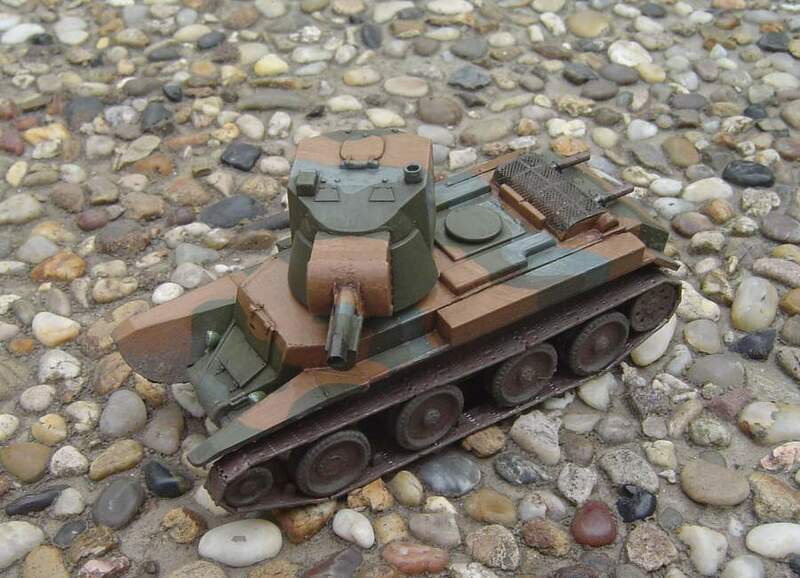 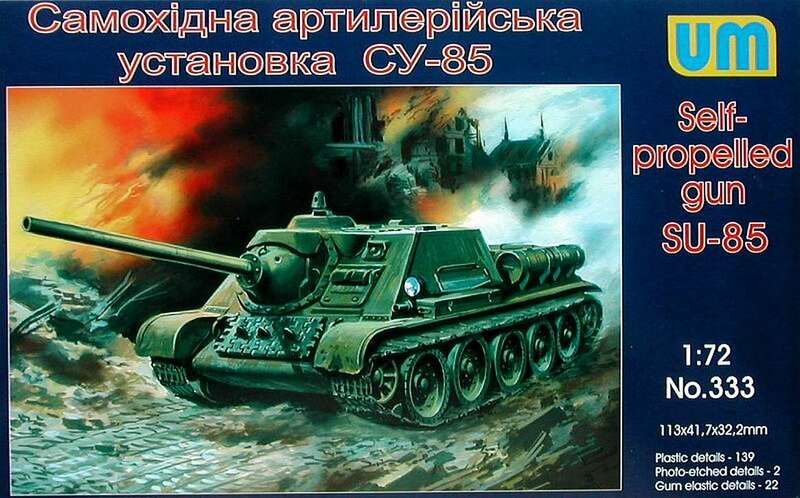 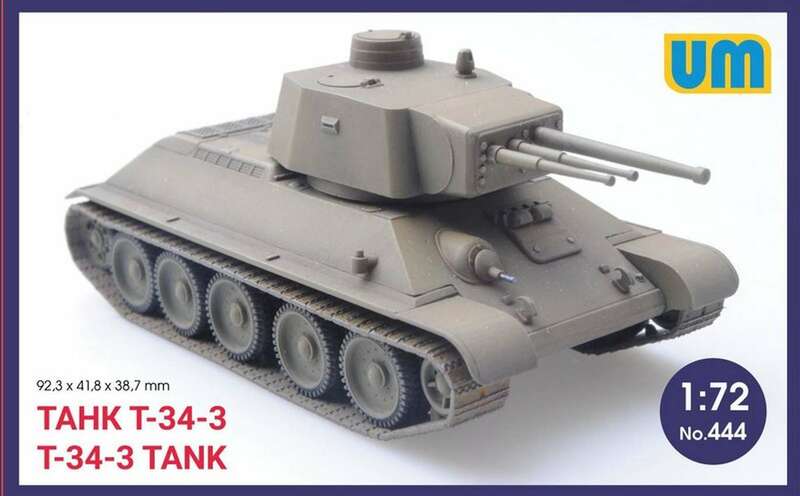 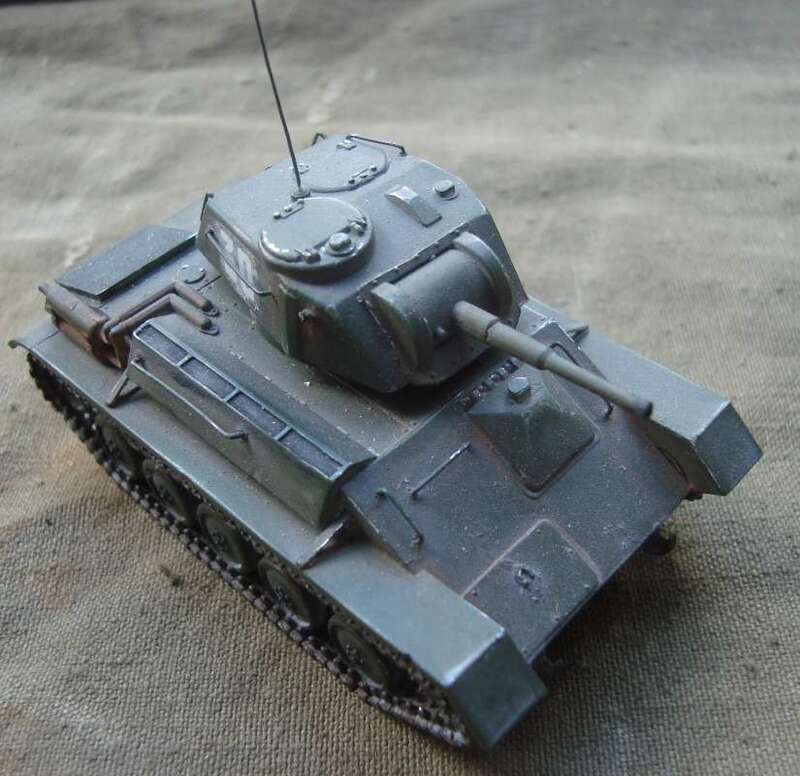 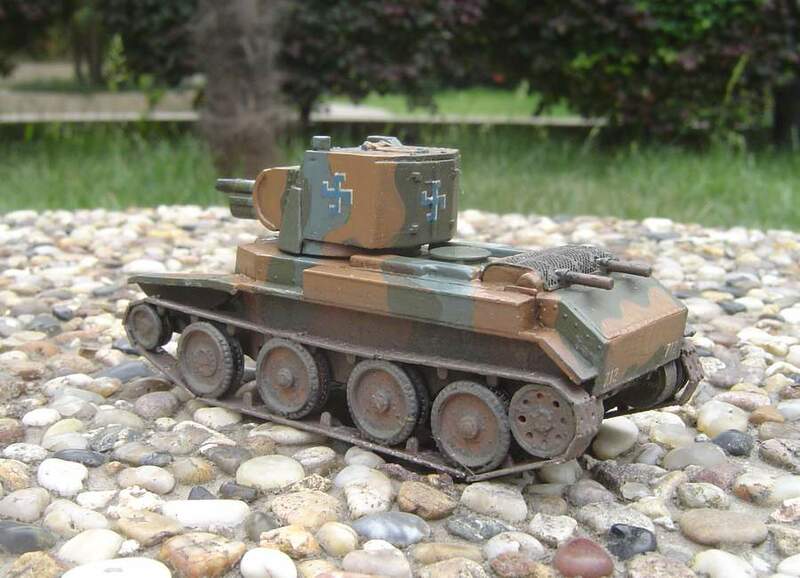 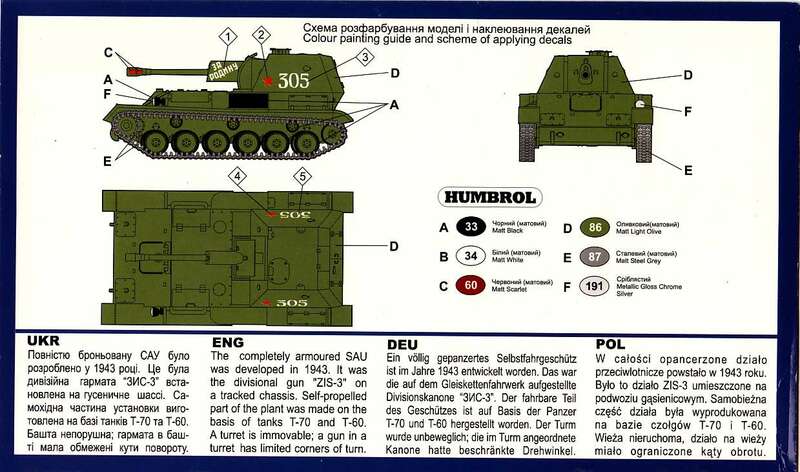 (model) 38 was destined to become one of the most widely used Czechoslovak tanks, although not in Czechoslovak hands. 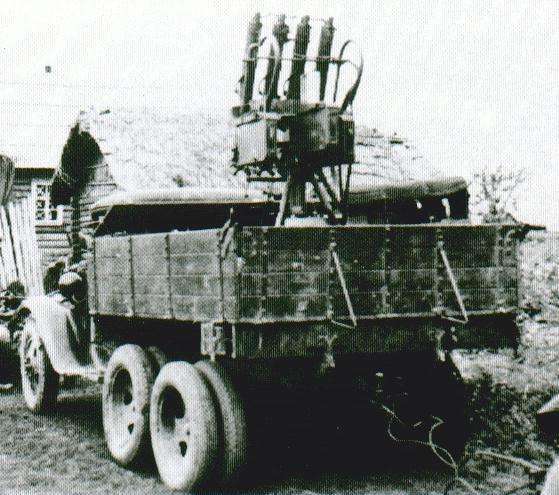 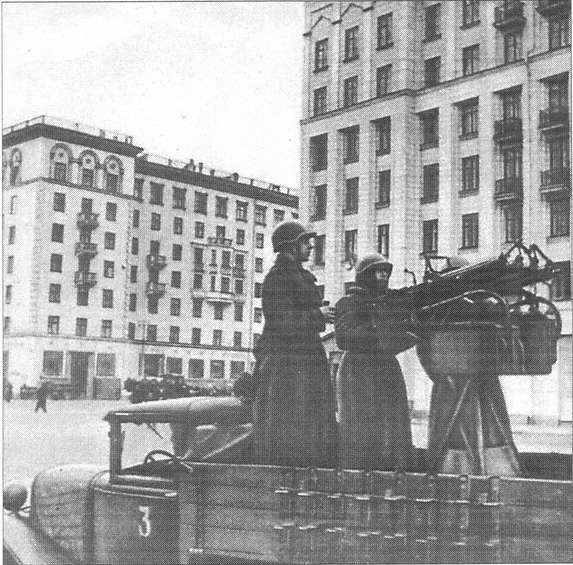 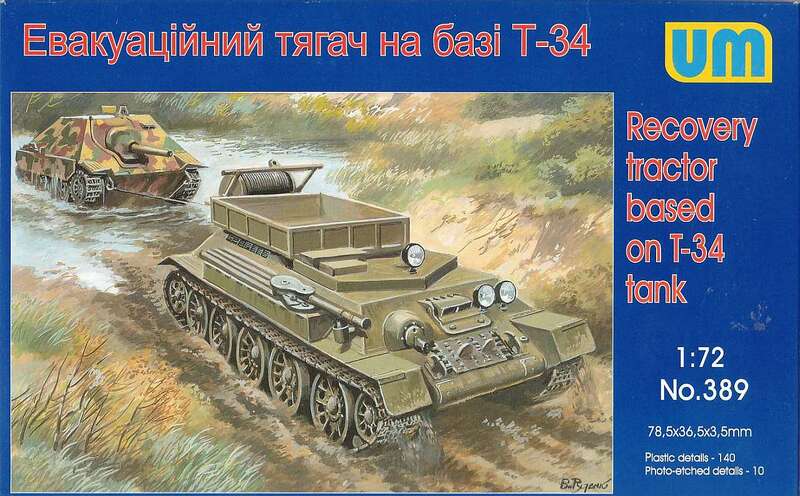 Ordered into production in 1938, the LT-38 drew on the experience from earlier LT-35 and became the most successful product of the Czechoslovak industry.LT-38 in different variants was exported to many countries and gained an excellent reputation among its foreign users such as Sweden (THN Sv), Iran / Persia (TNH), Peru (LTP), Switzerland (LTH - Pz39) and Lithuania (LTL). 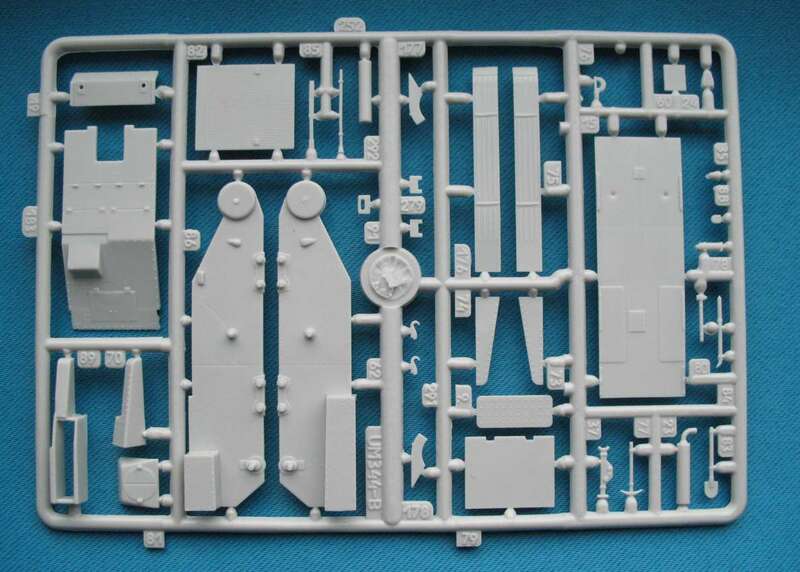 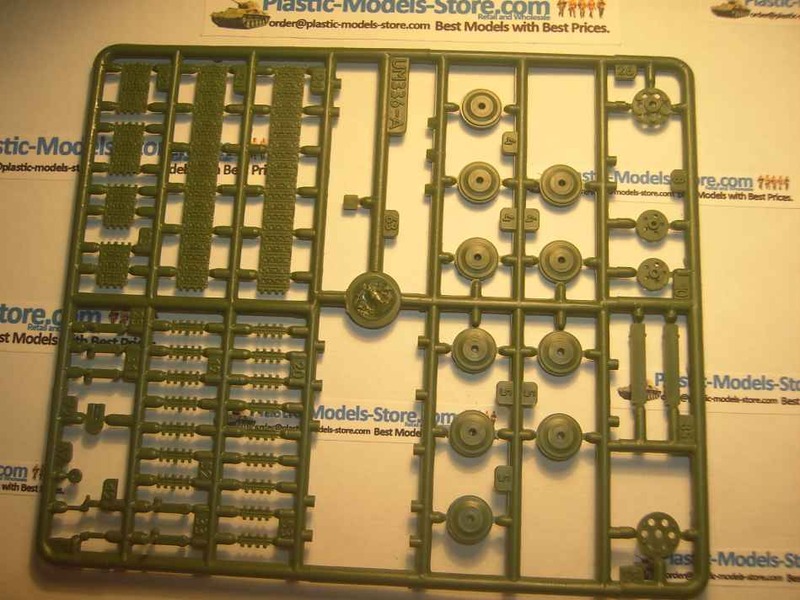 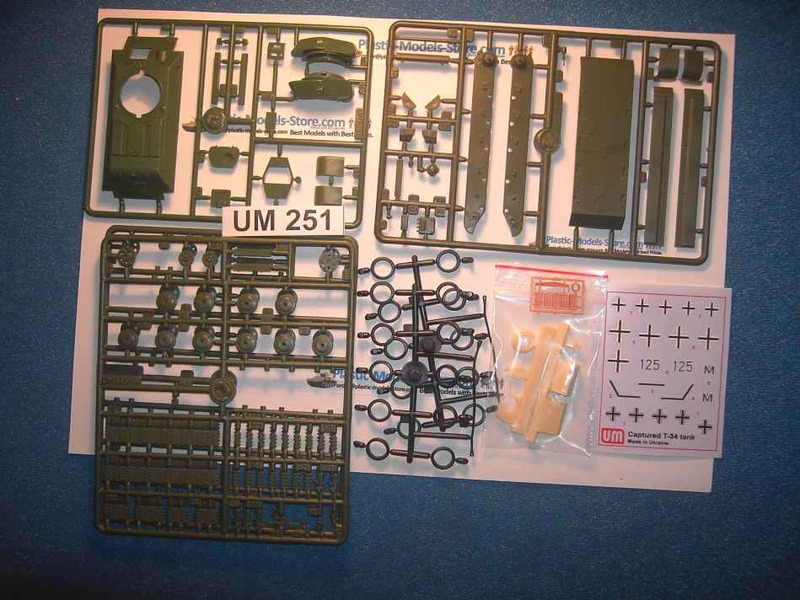 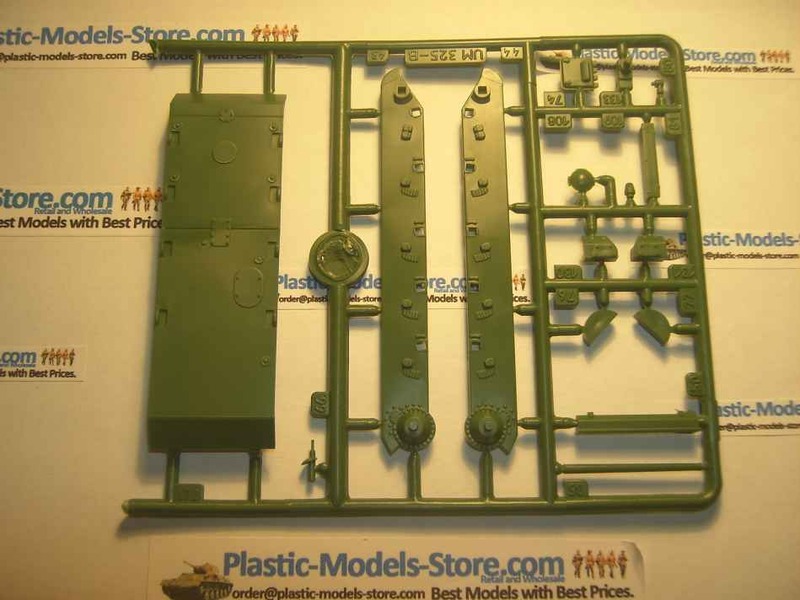 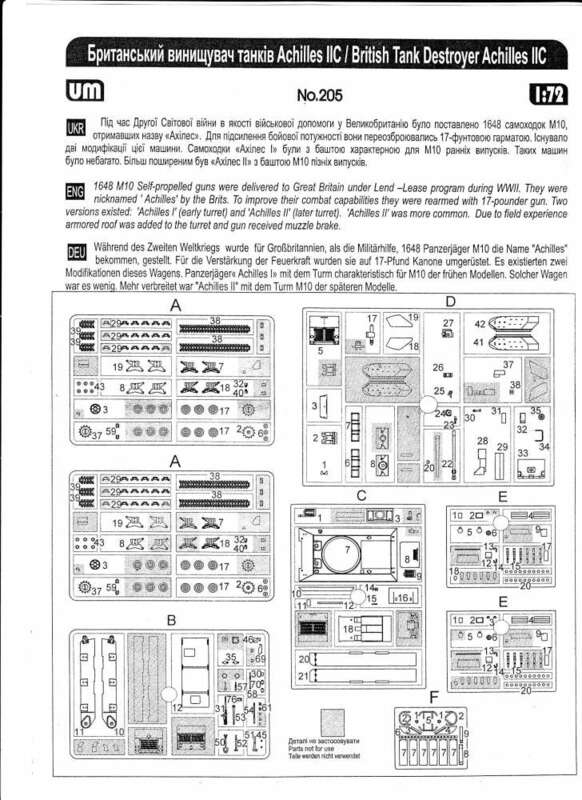 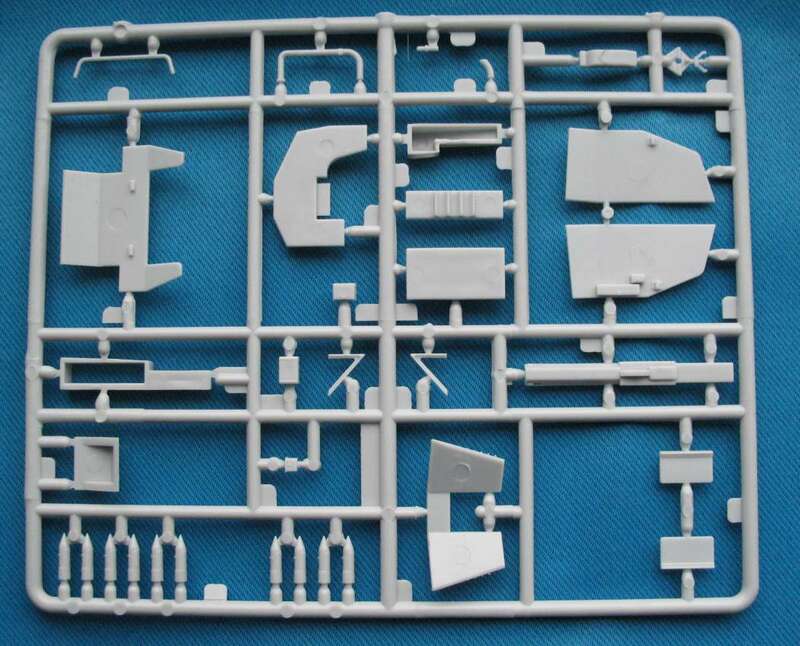 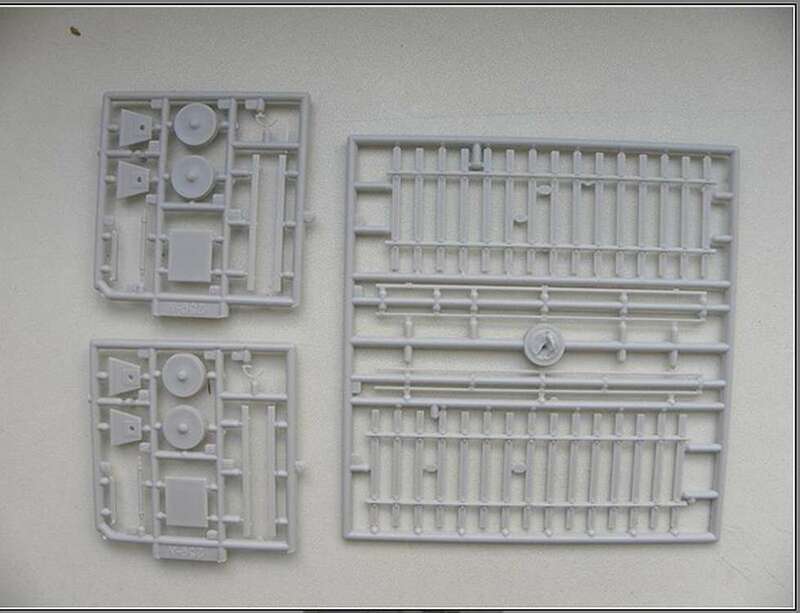 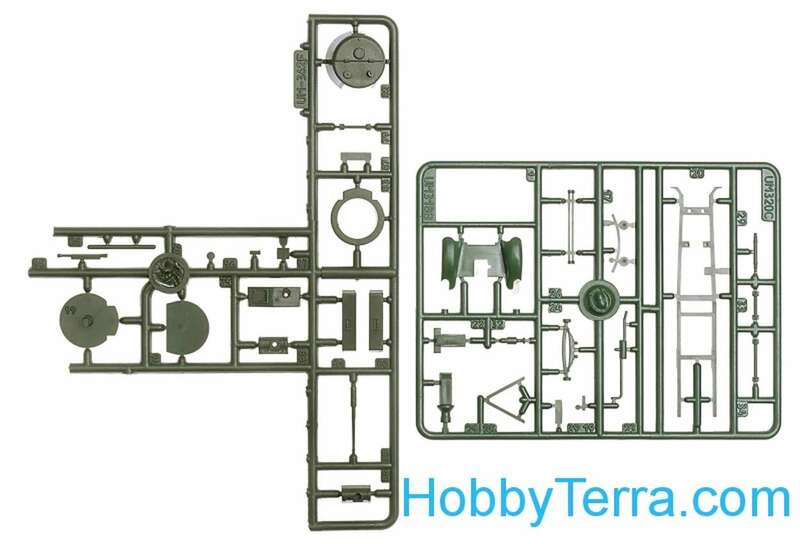 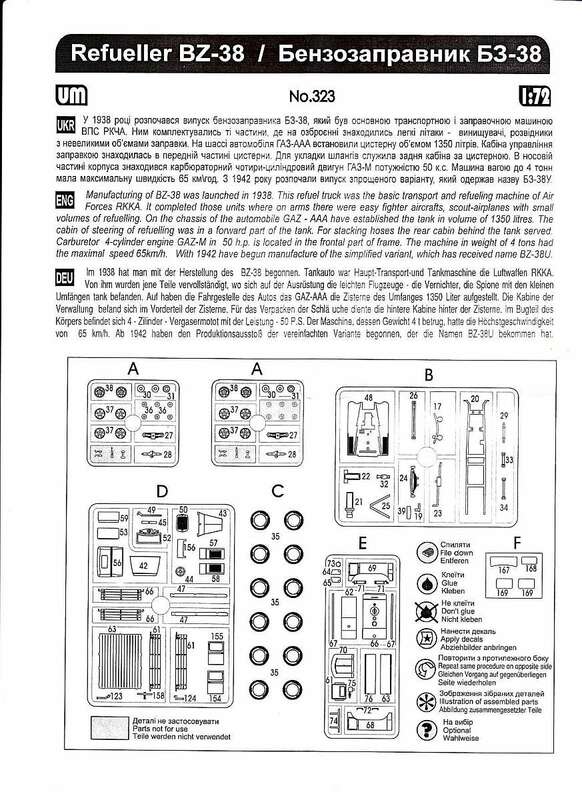 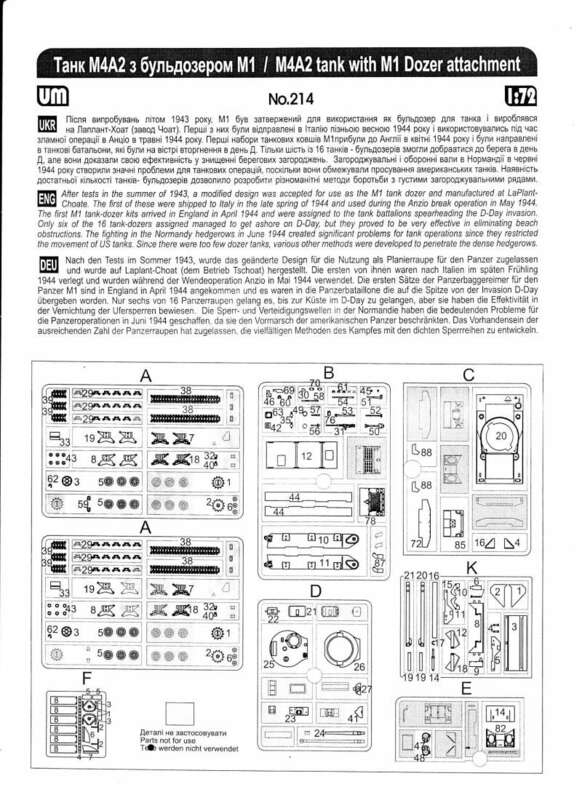 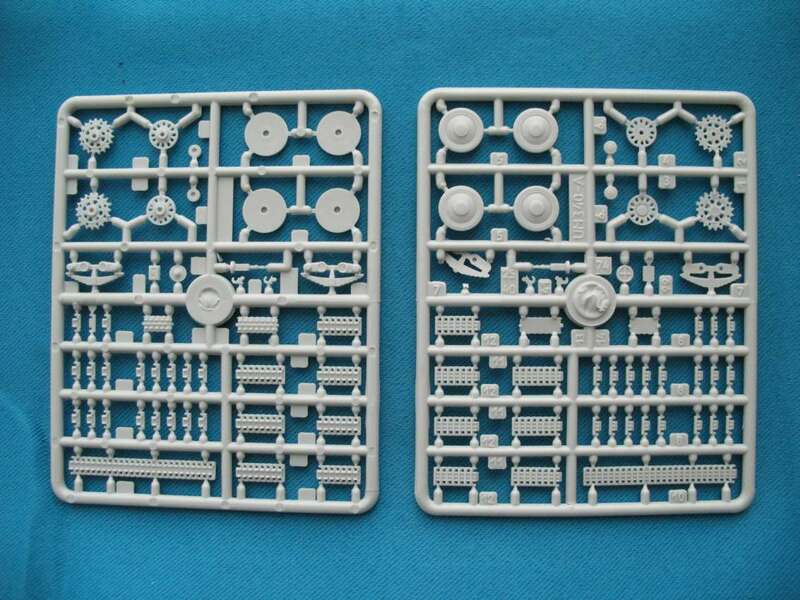 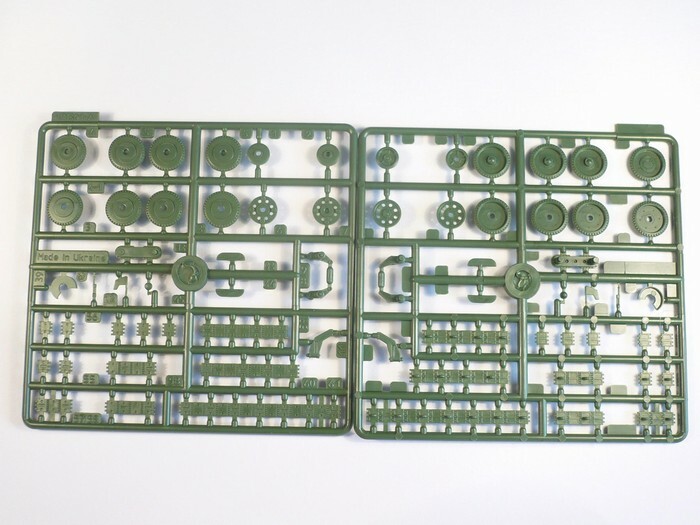 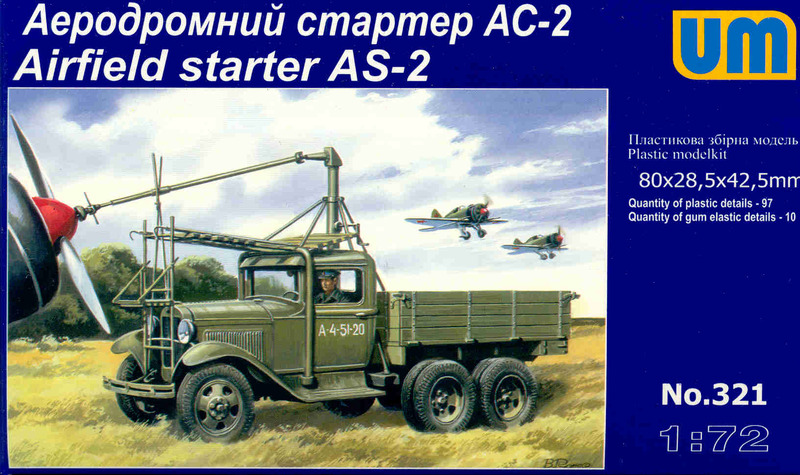 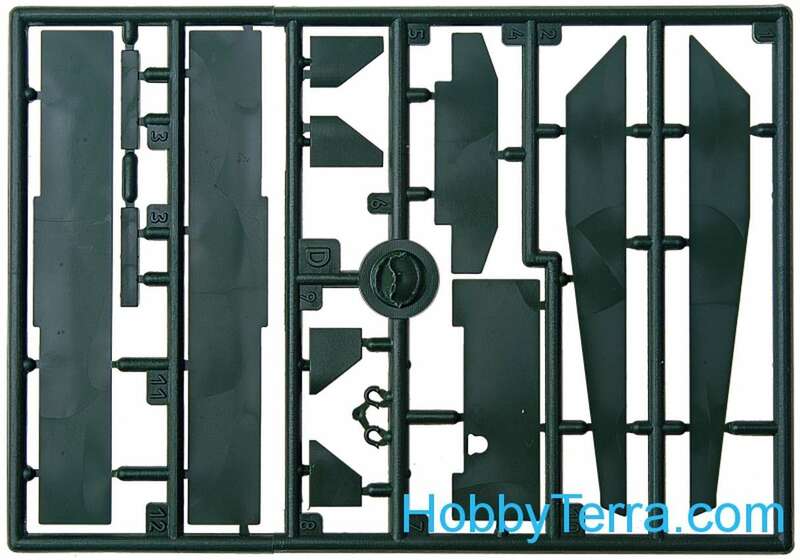 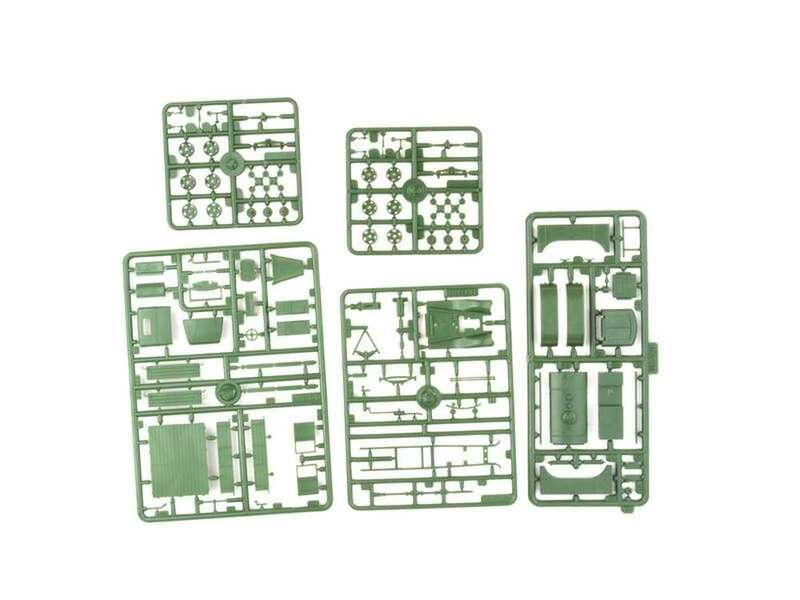 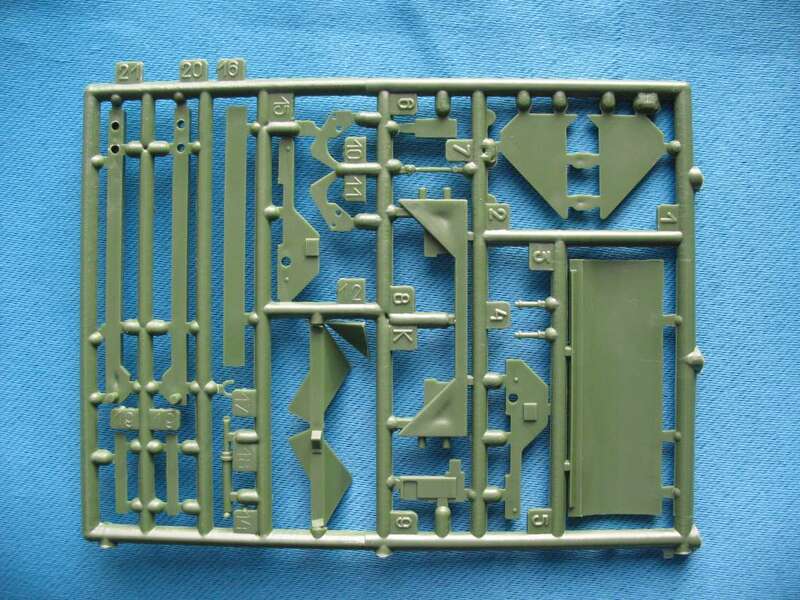 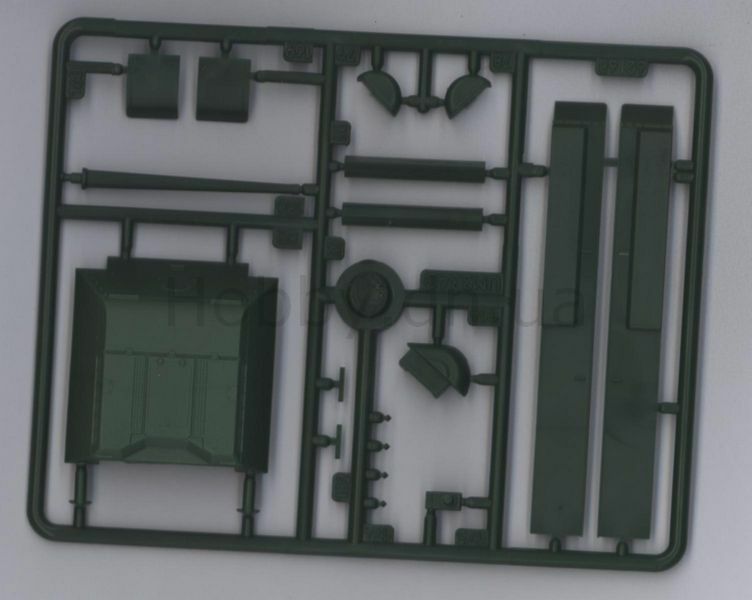 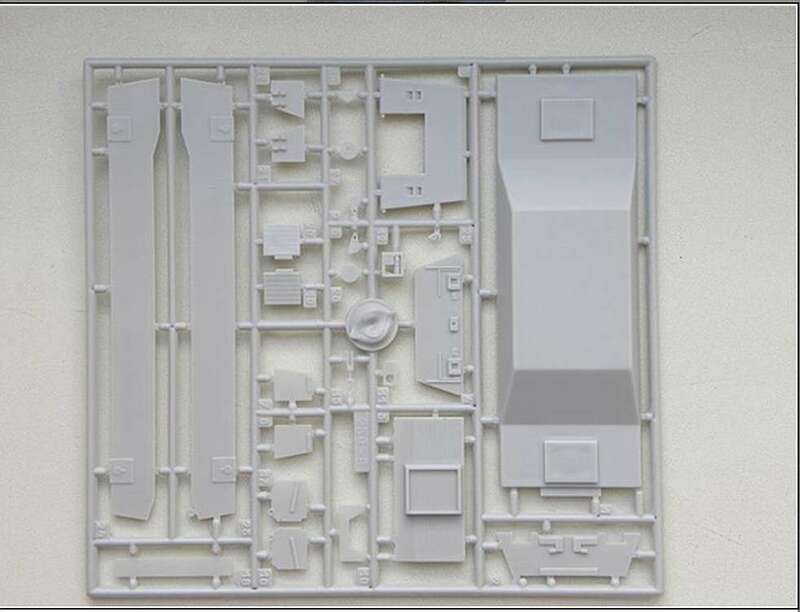 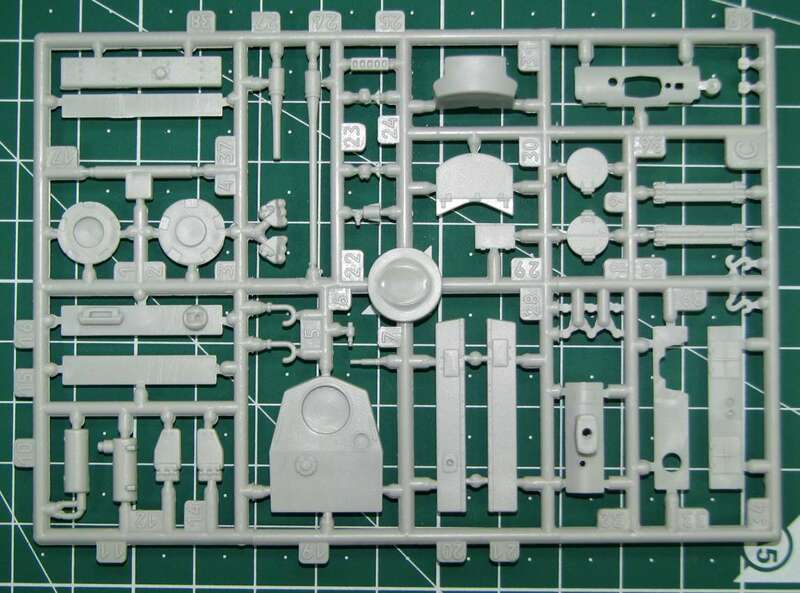 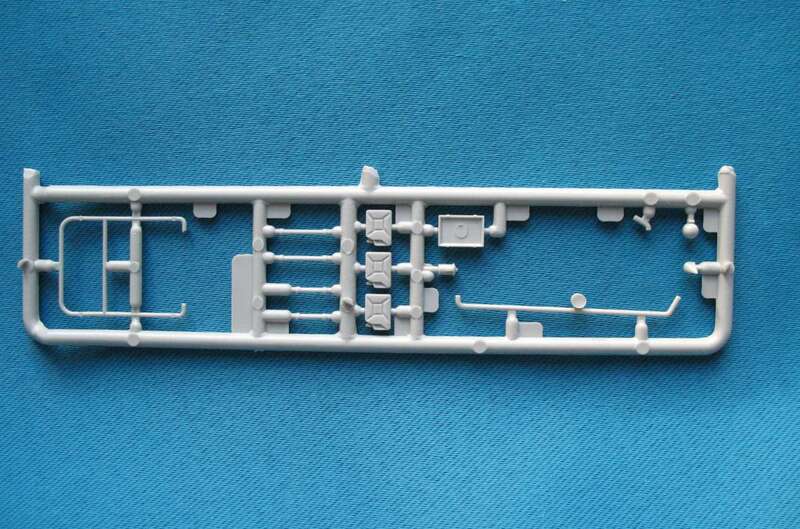 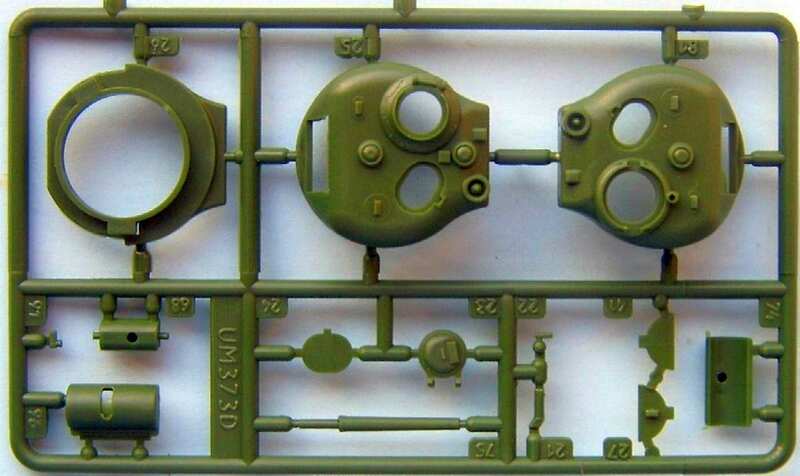 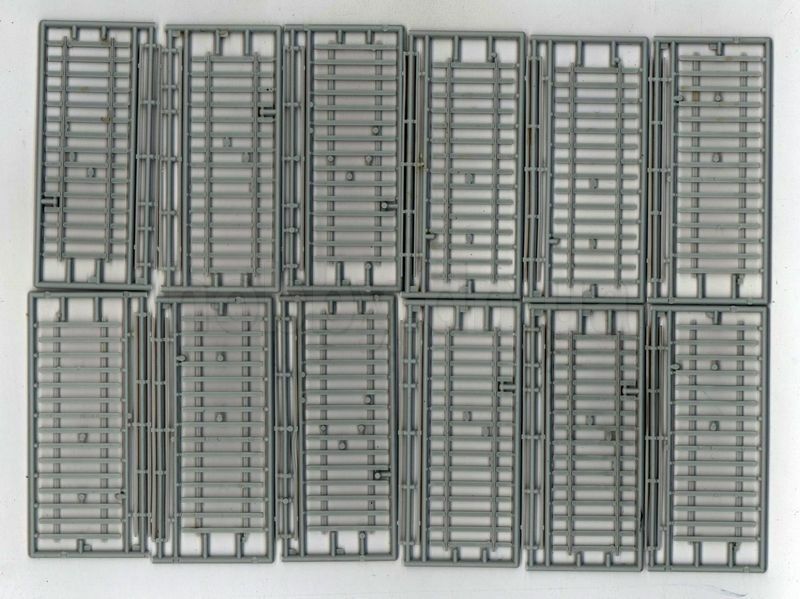 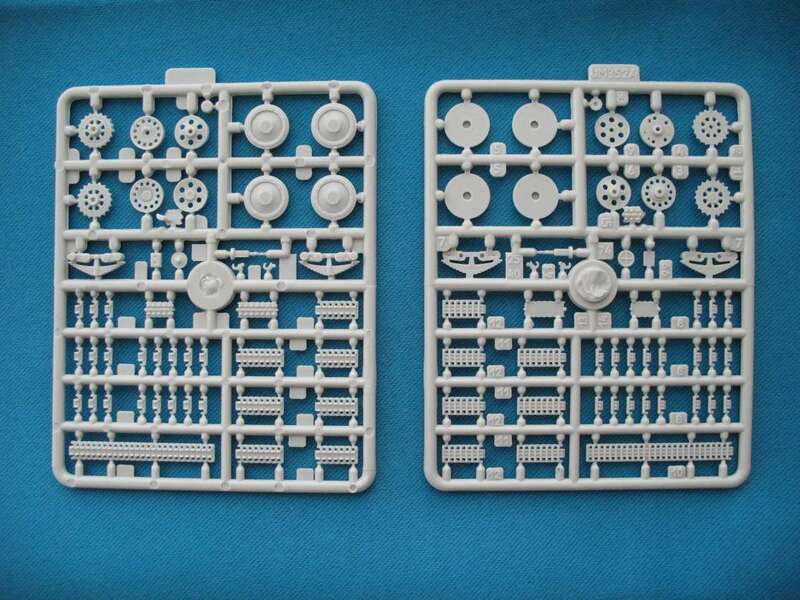 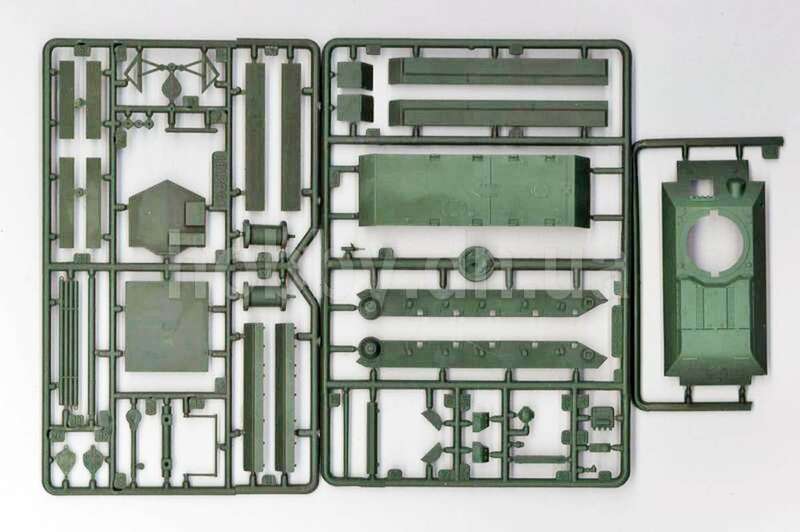 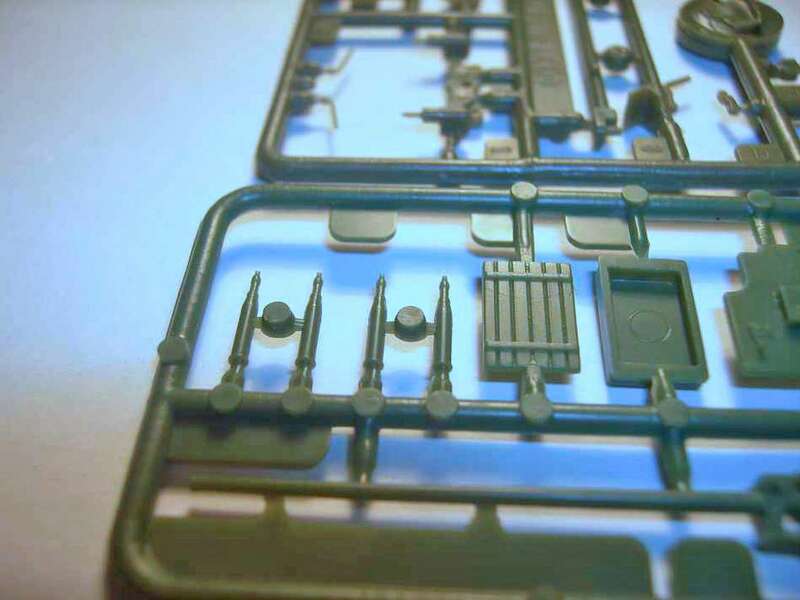 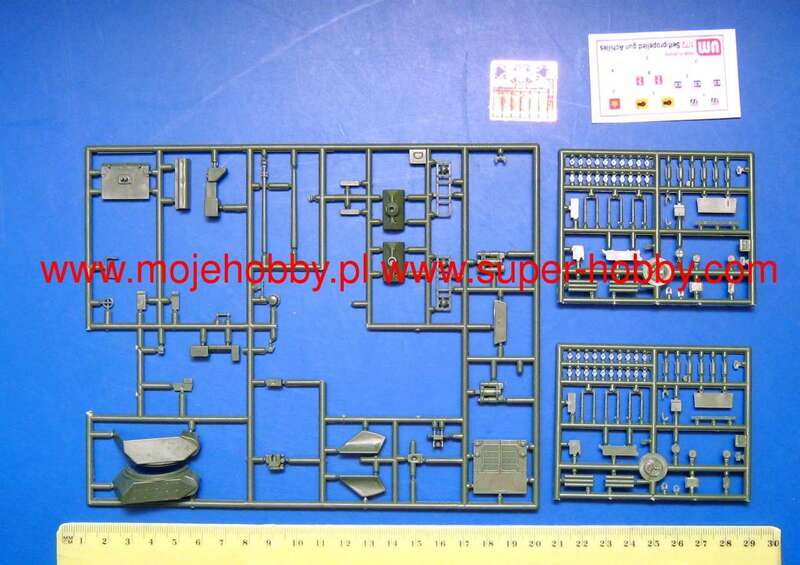 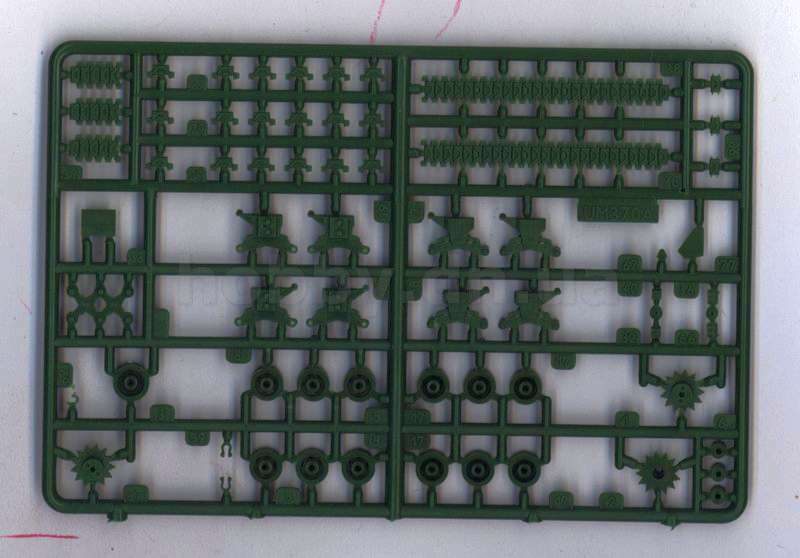 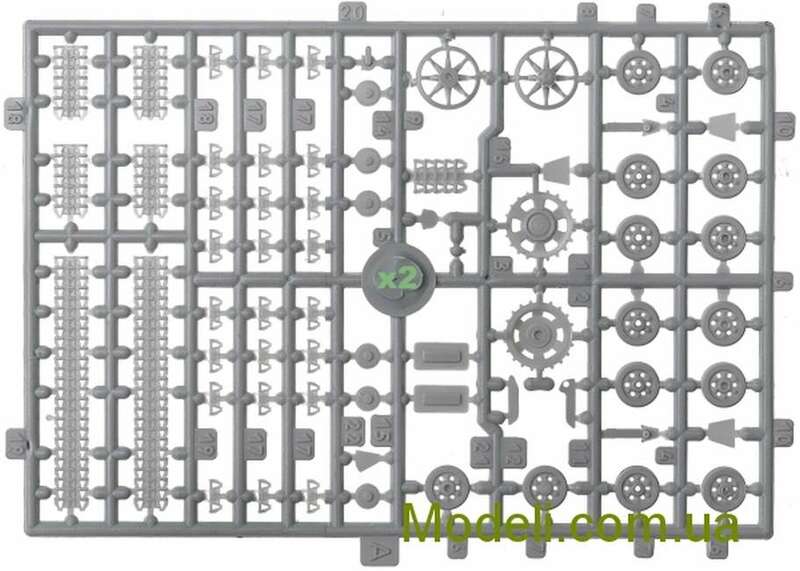 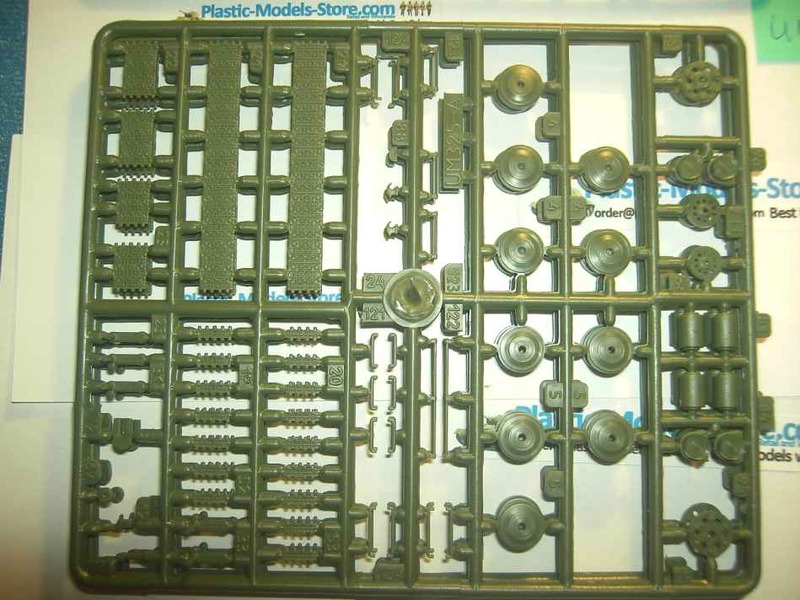 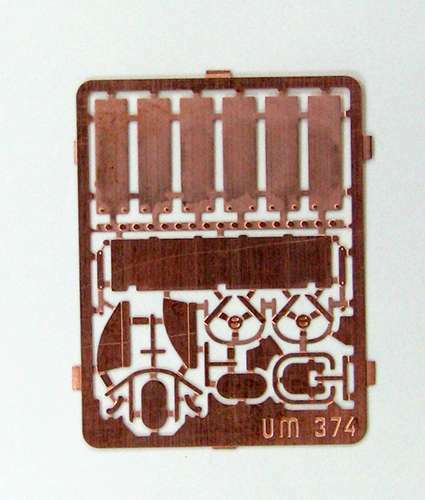 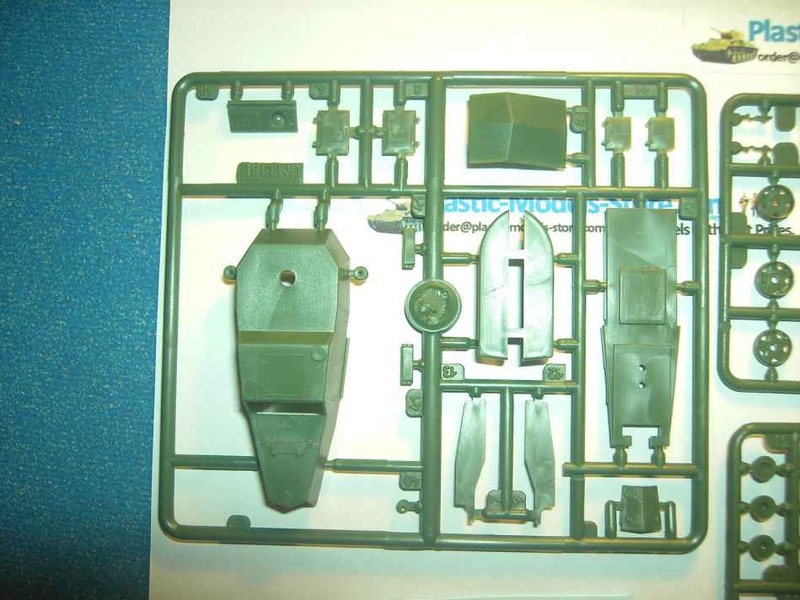 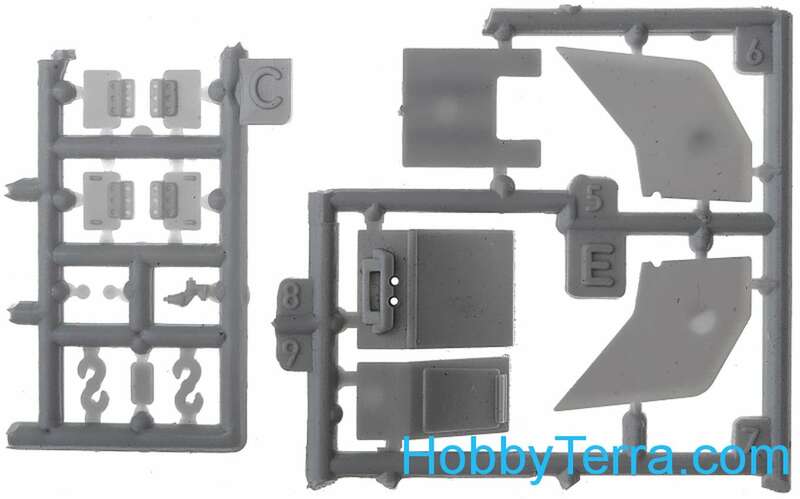 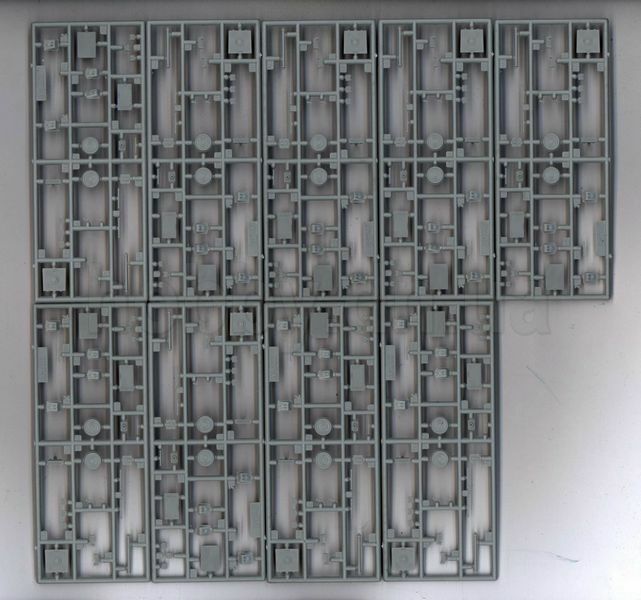 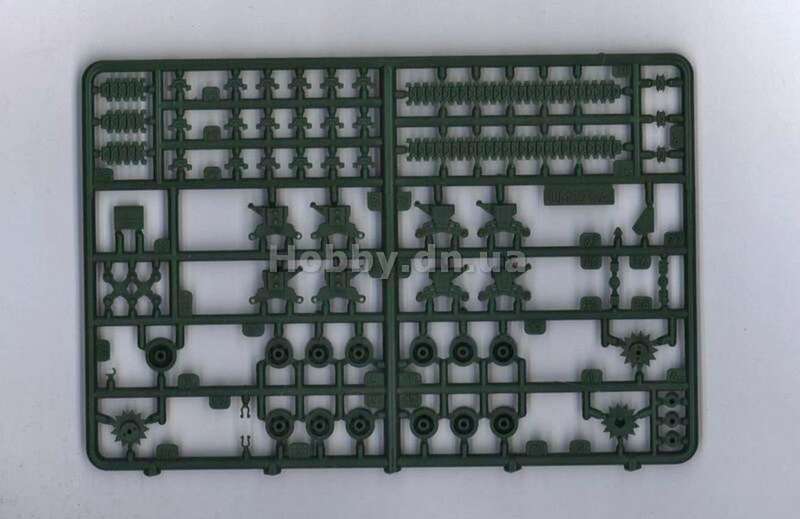 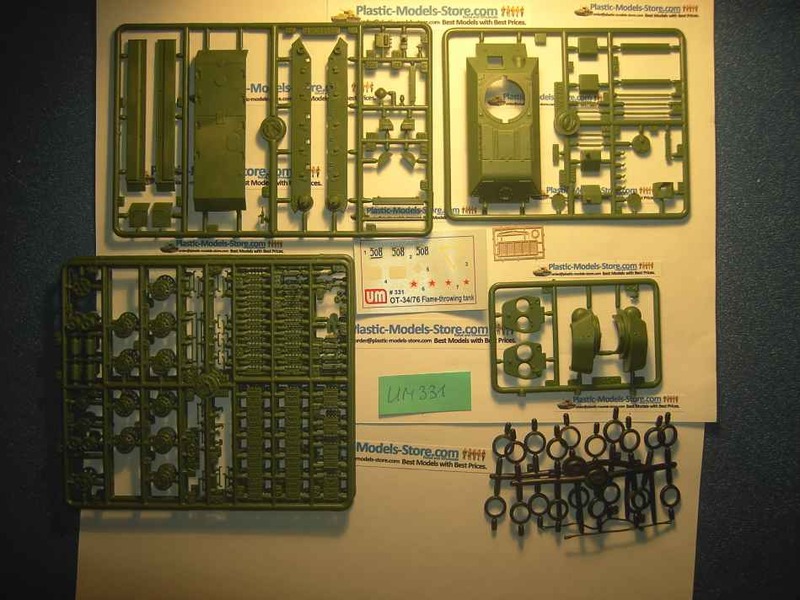 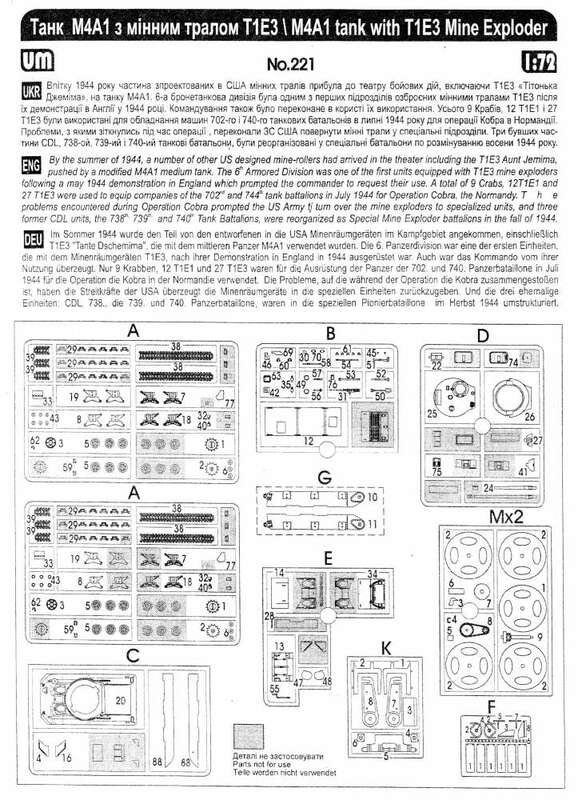 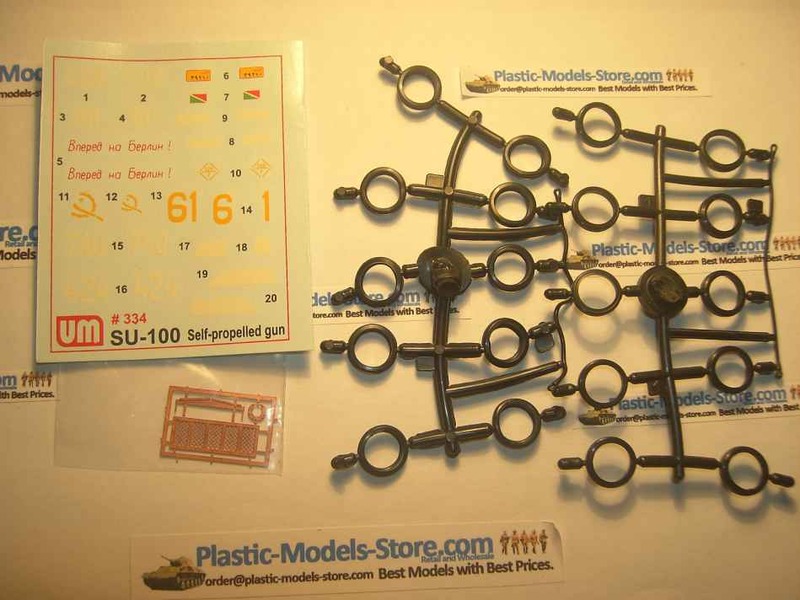 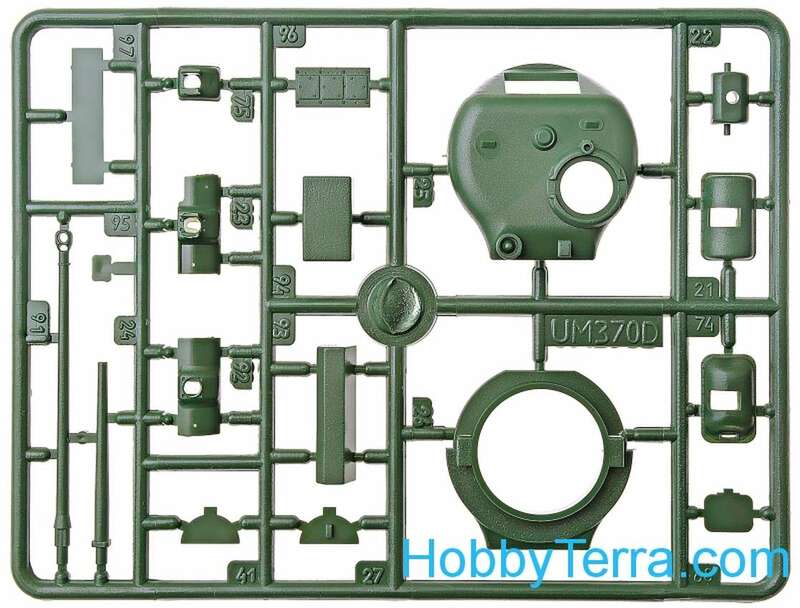 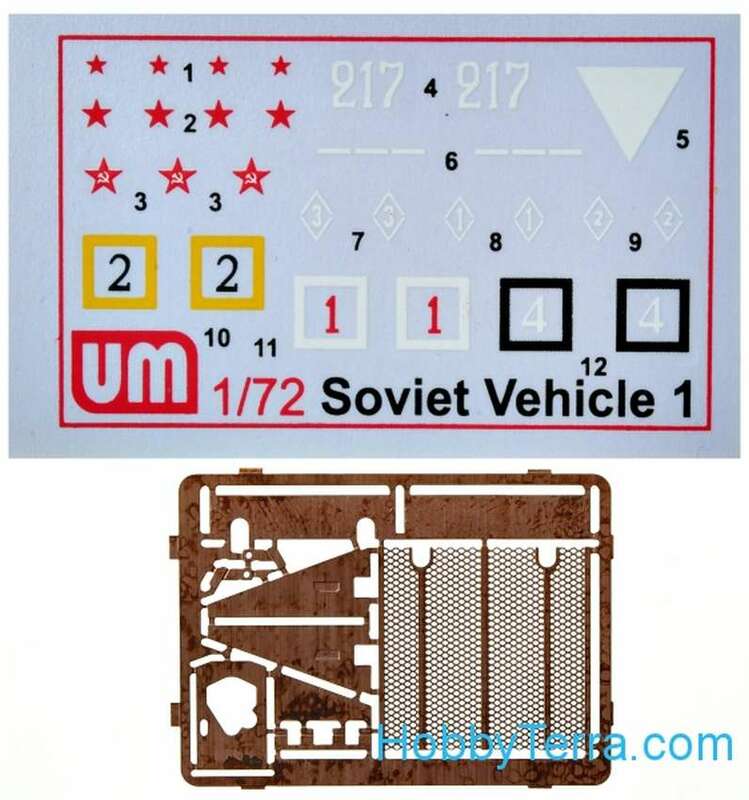 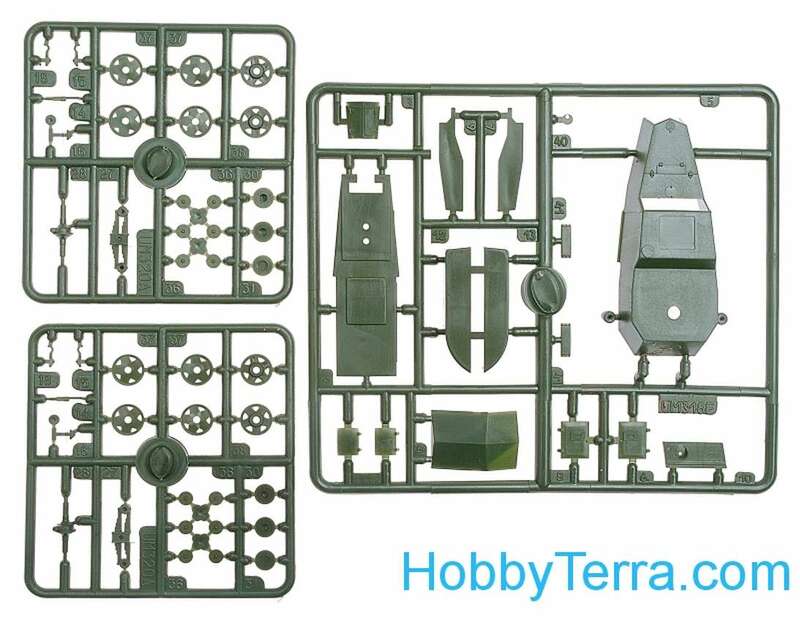 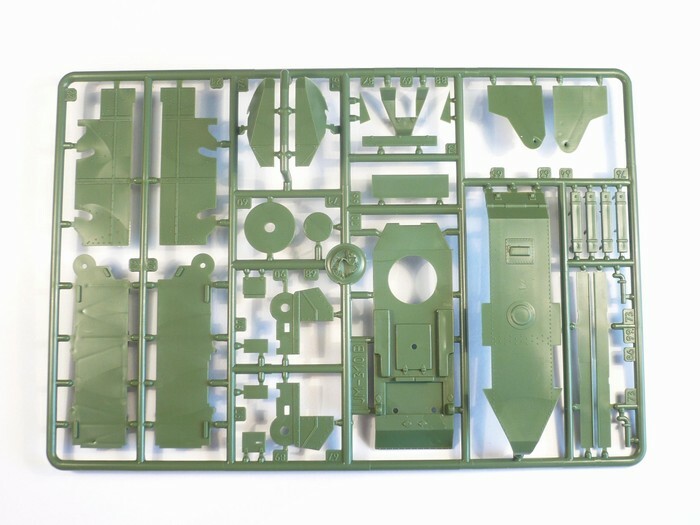 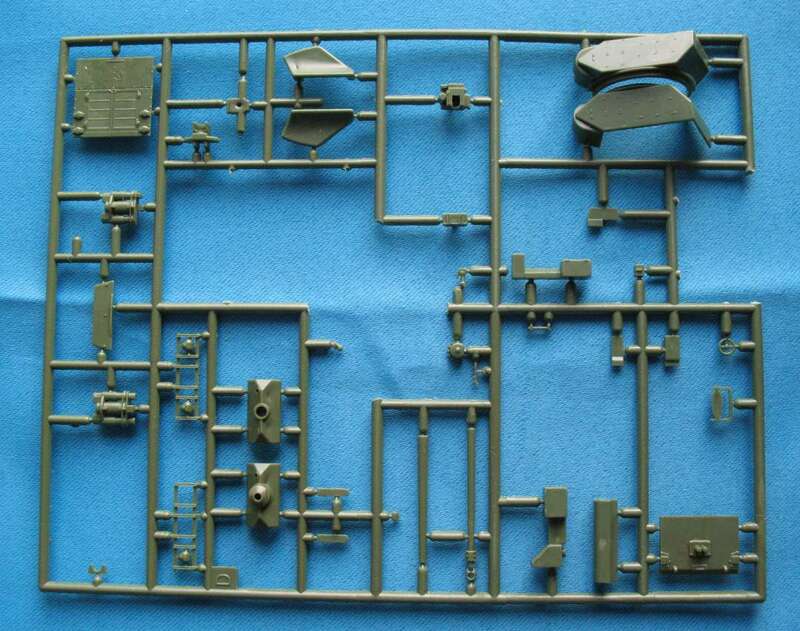 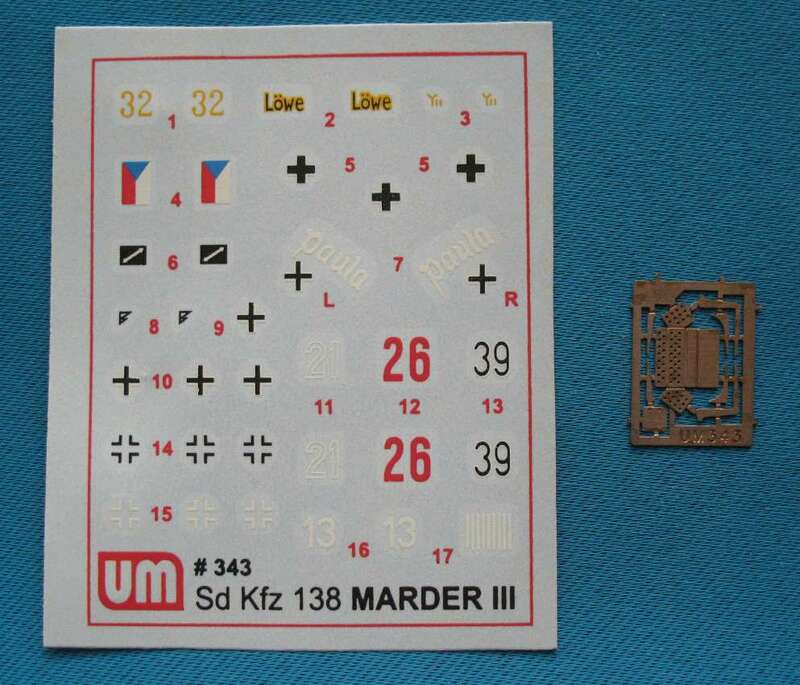 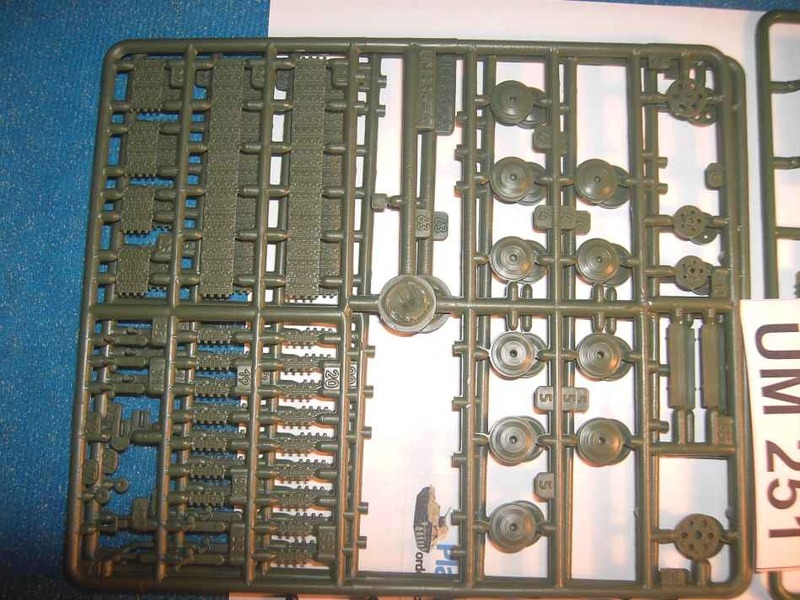 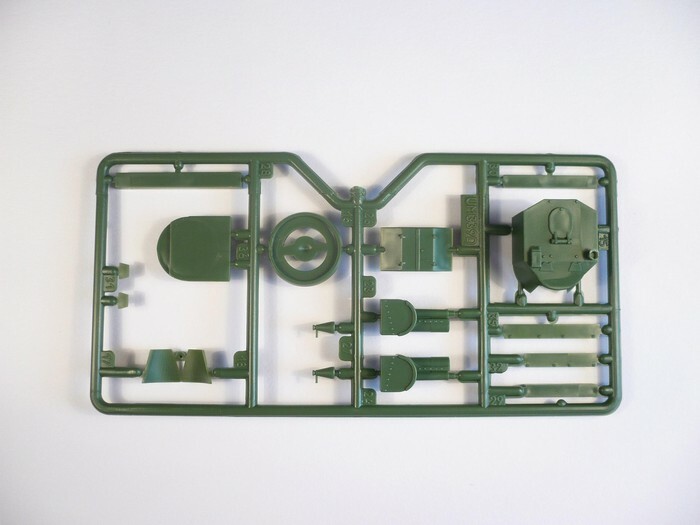 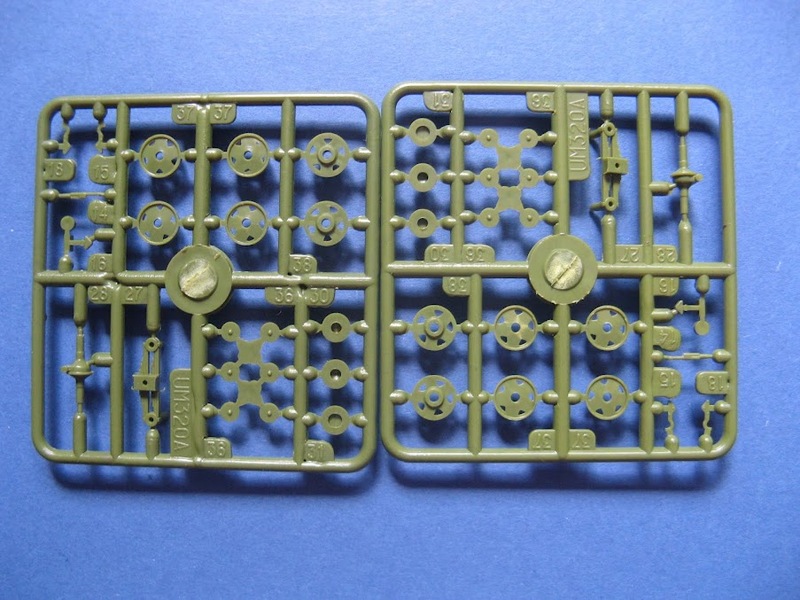 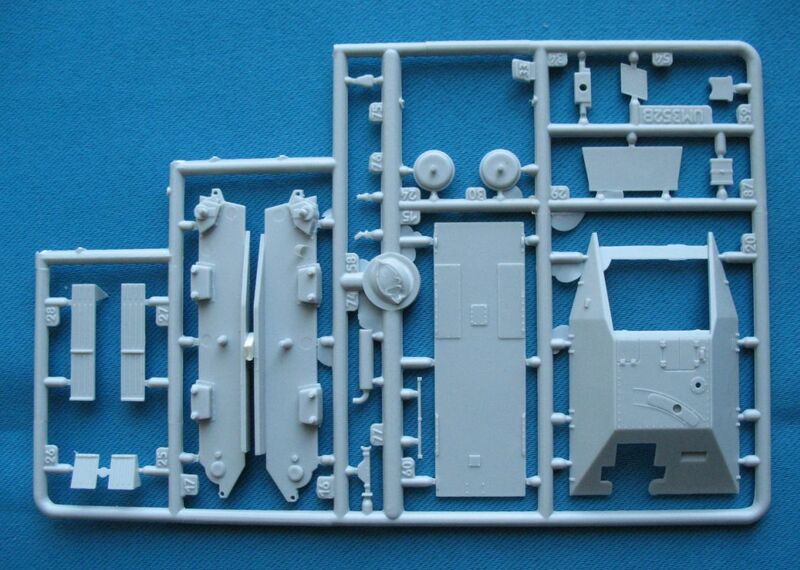 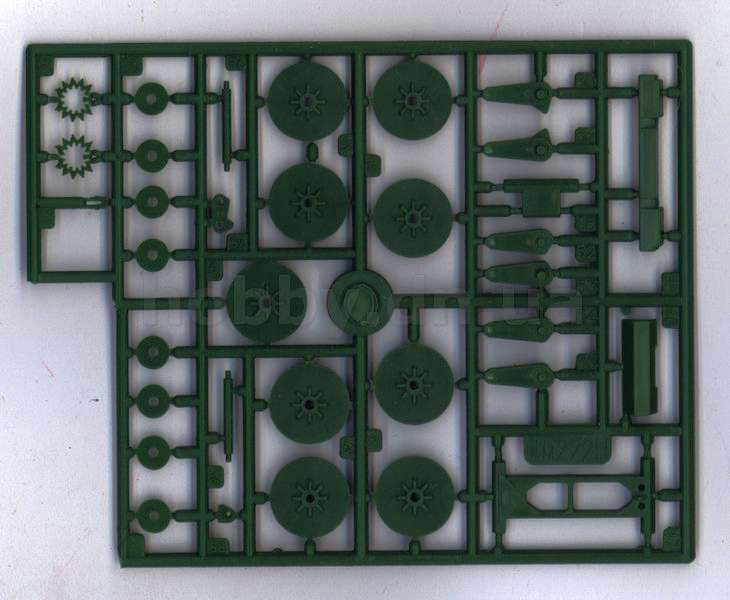 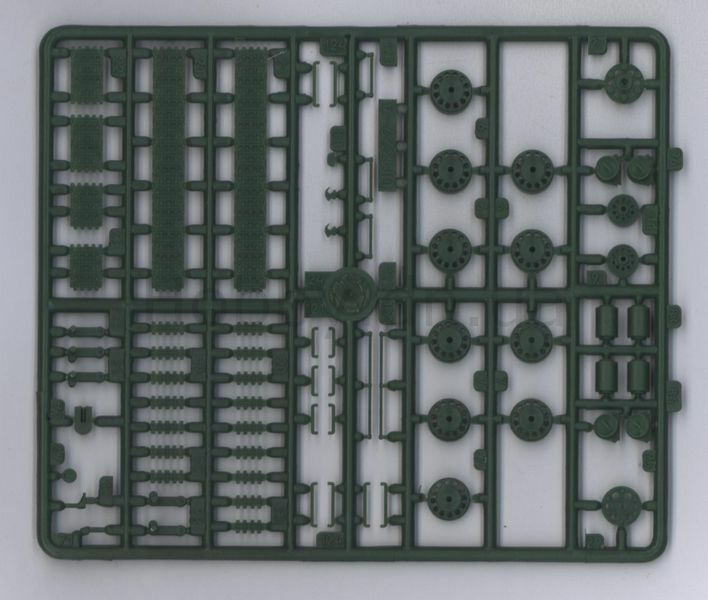 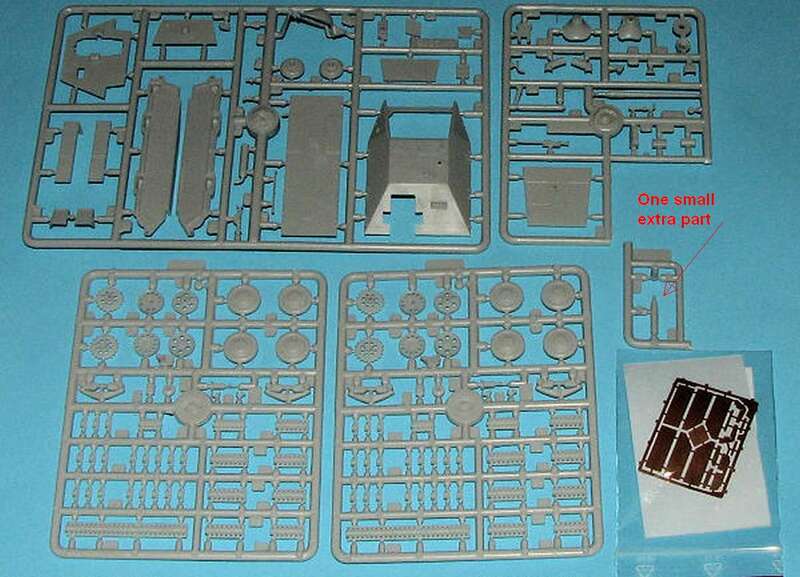 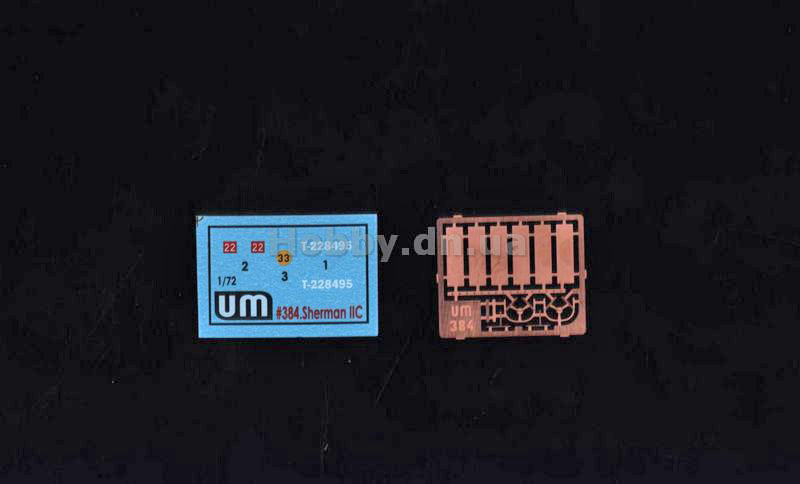 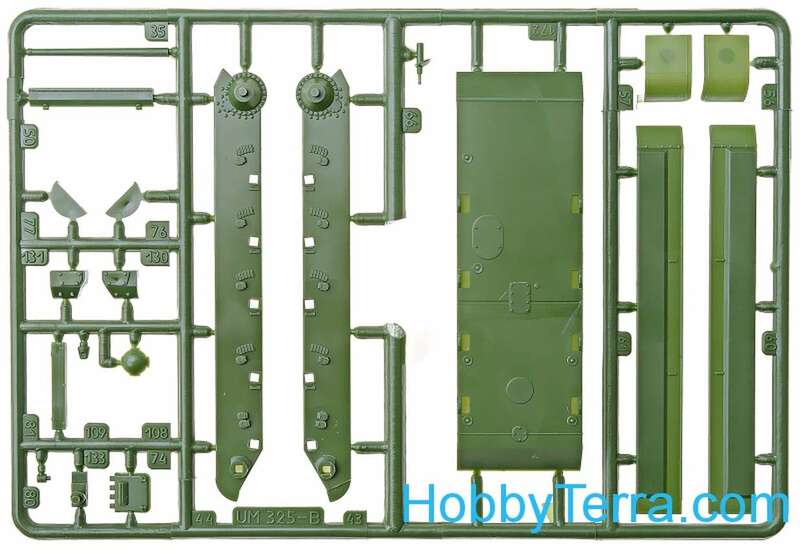 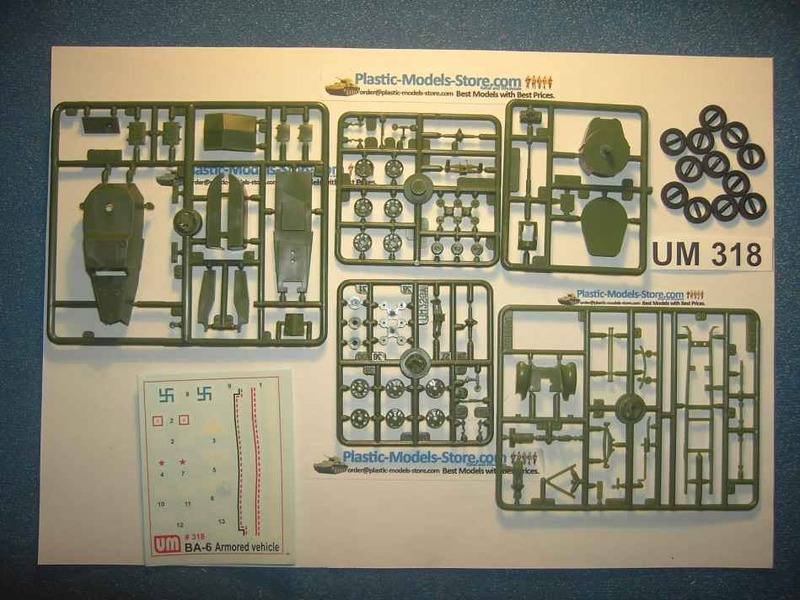 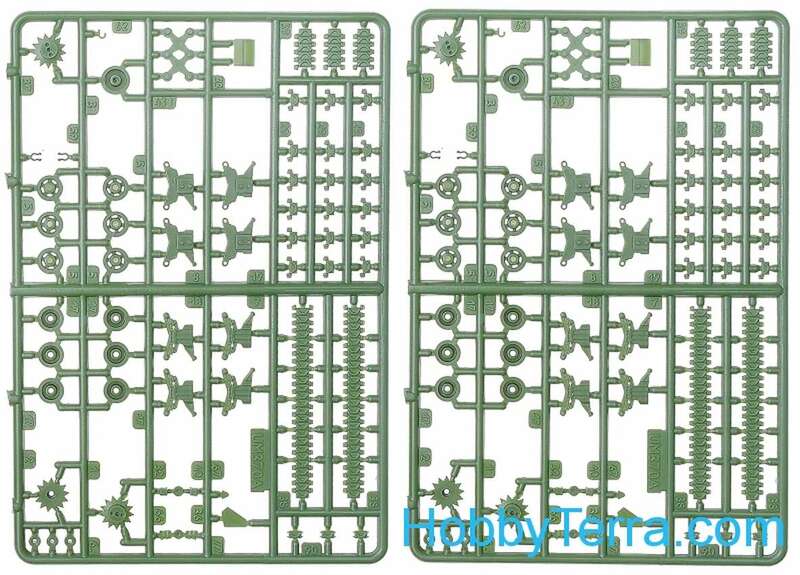 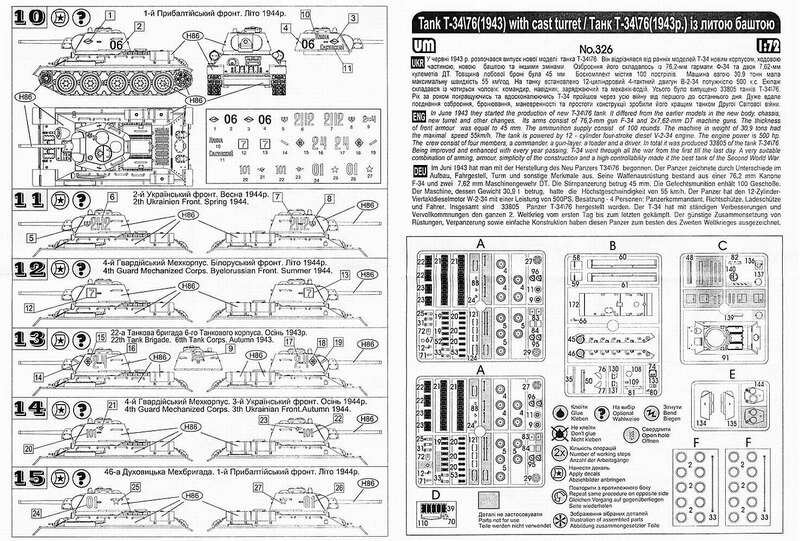 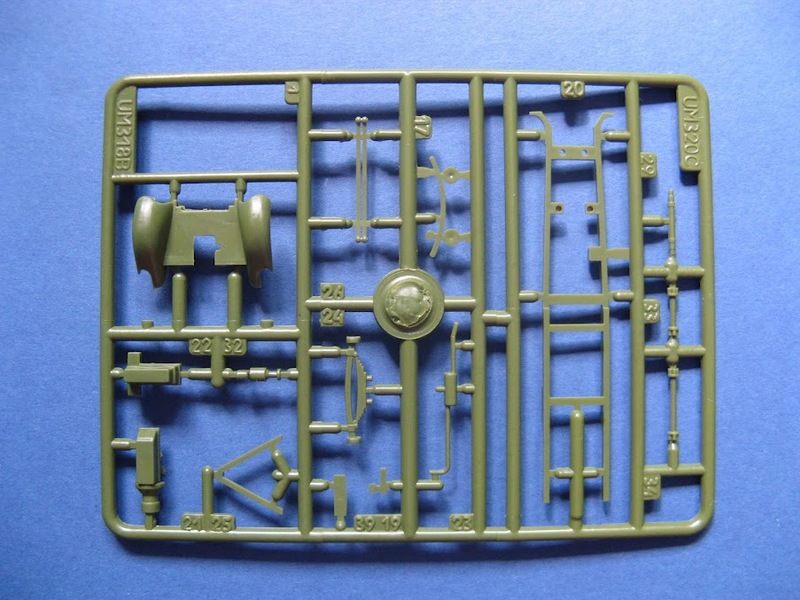 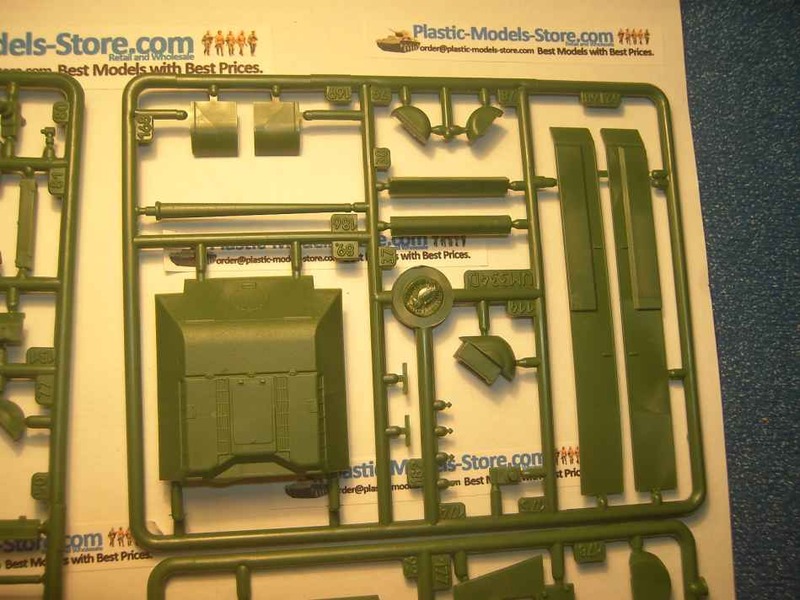 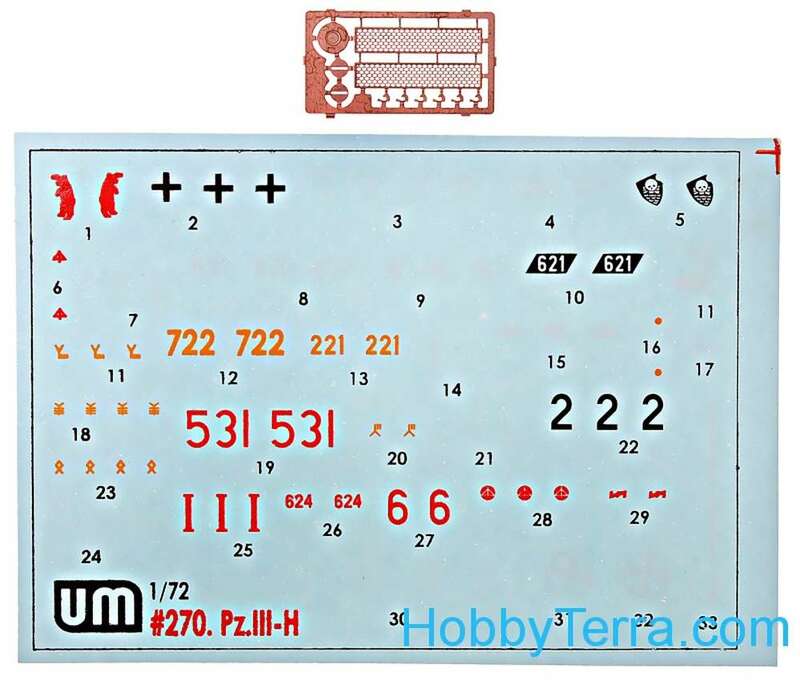 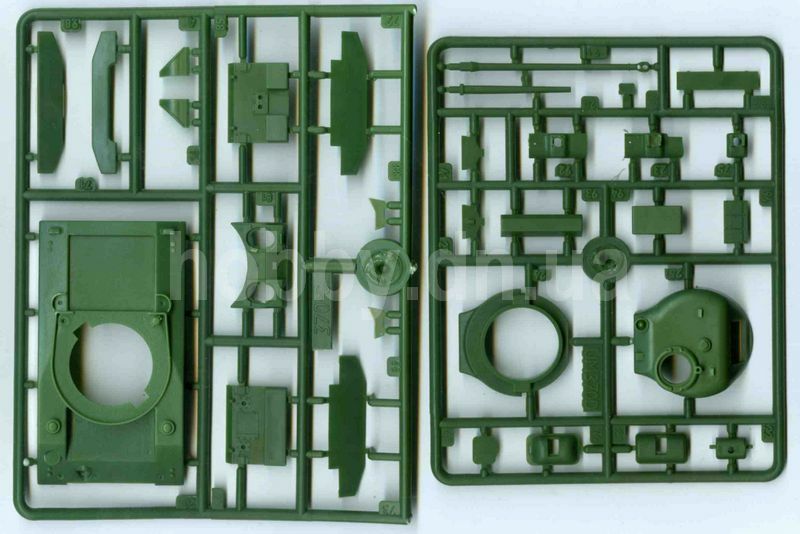 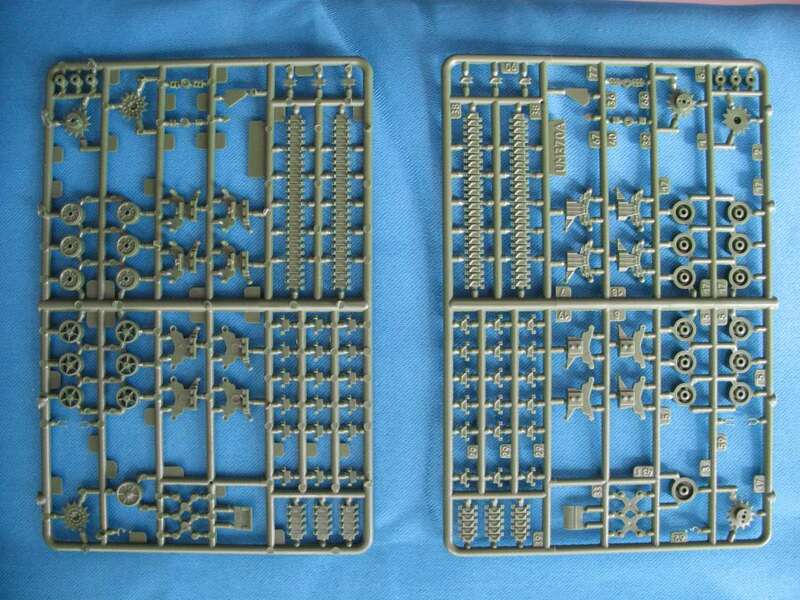 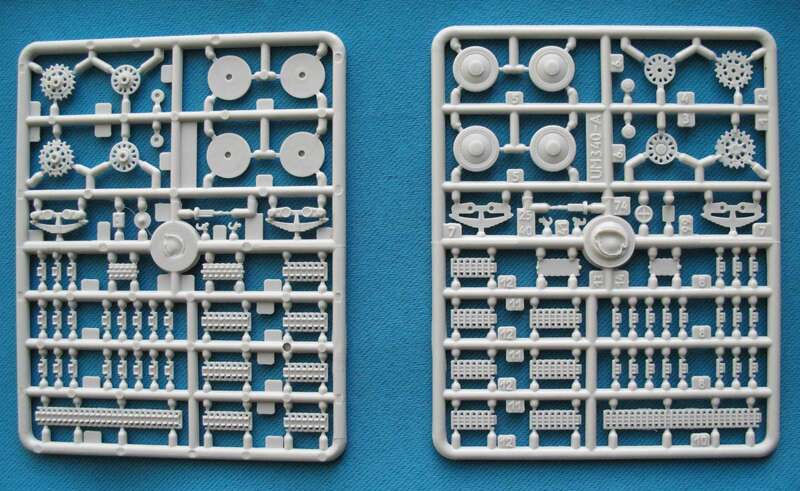 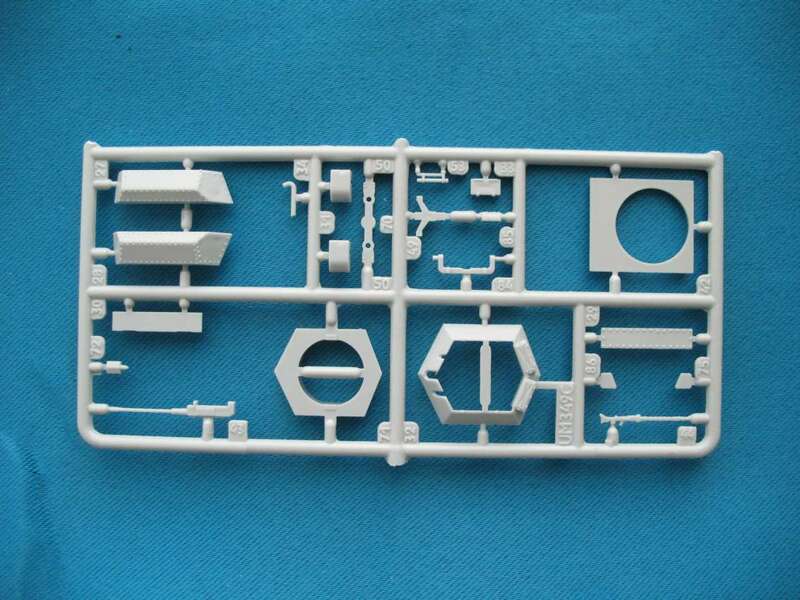 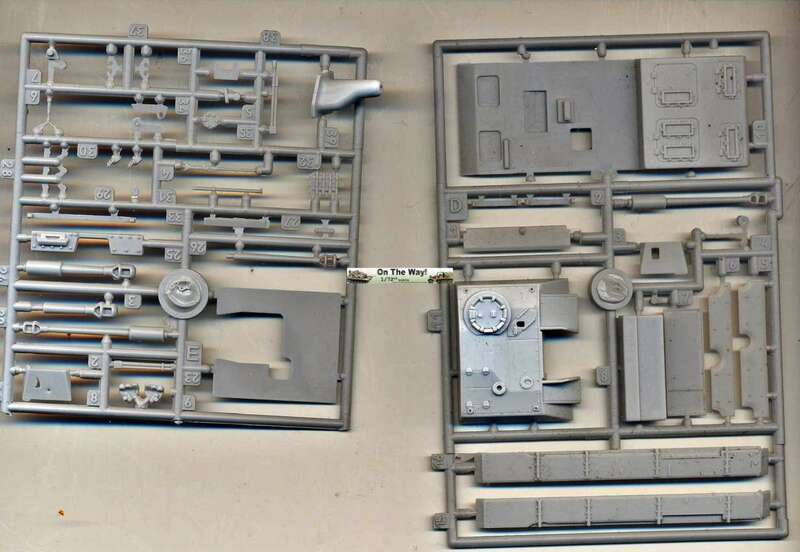 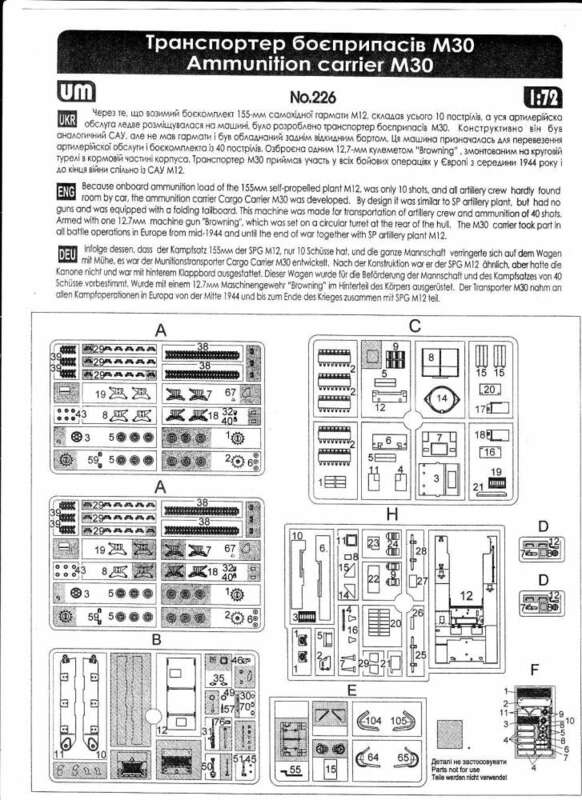 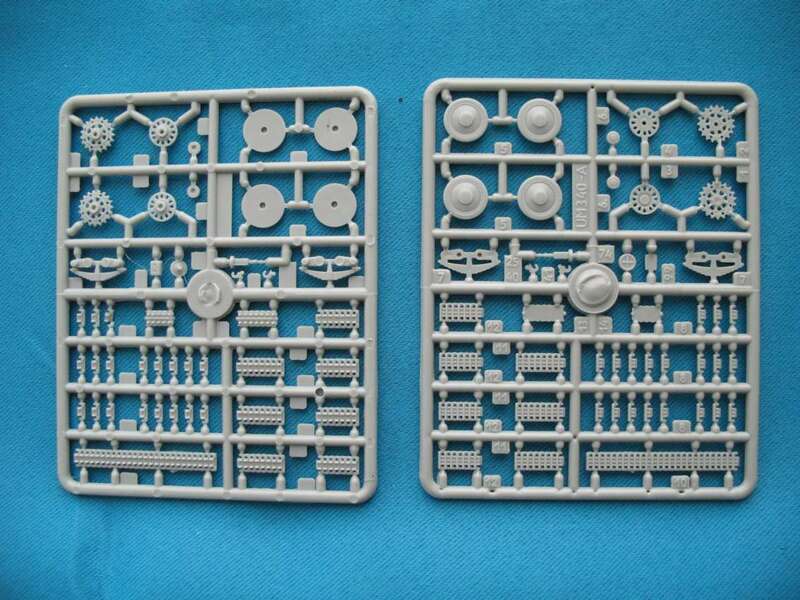 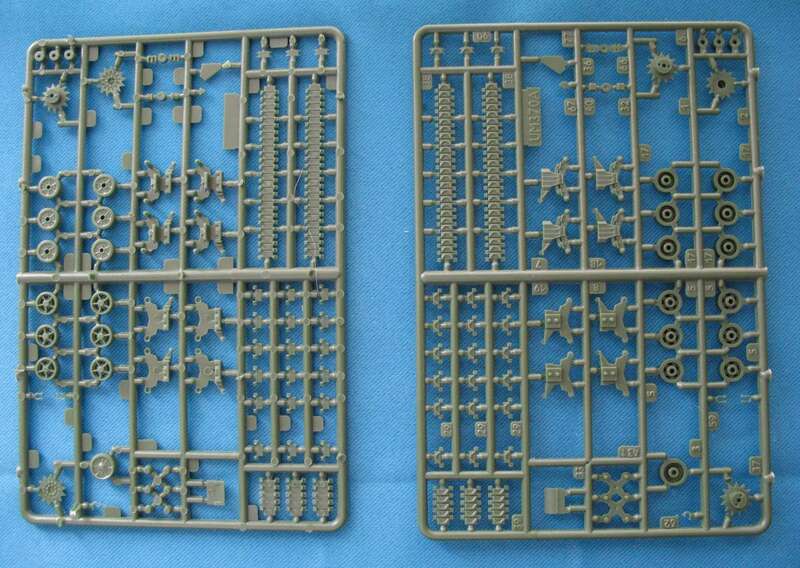 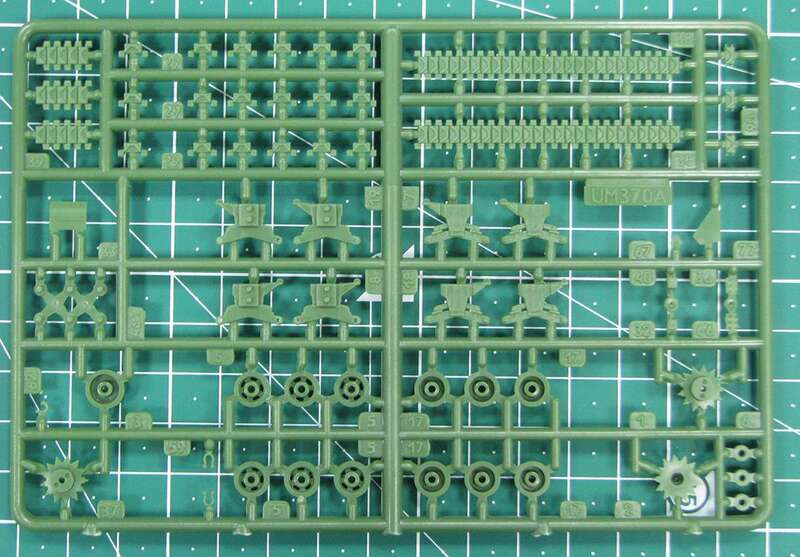 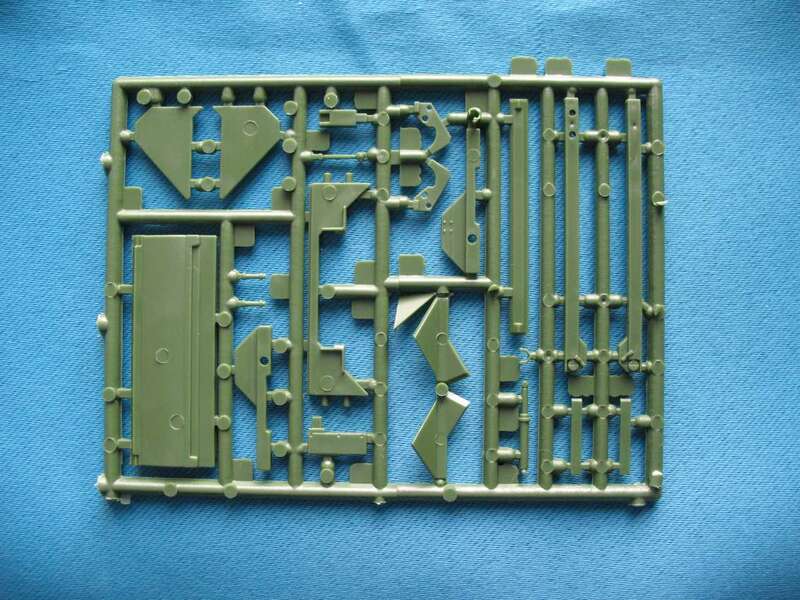 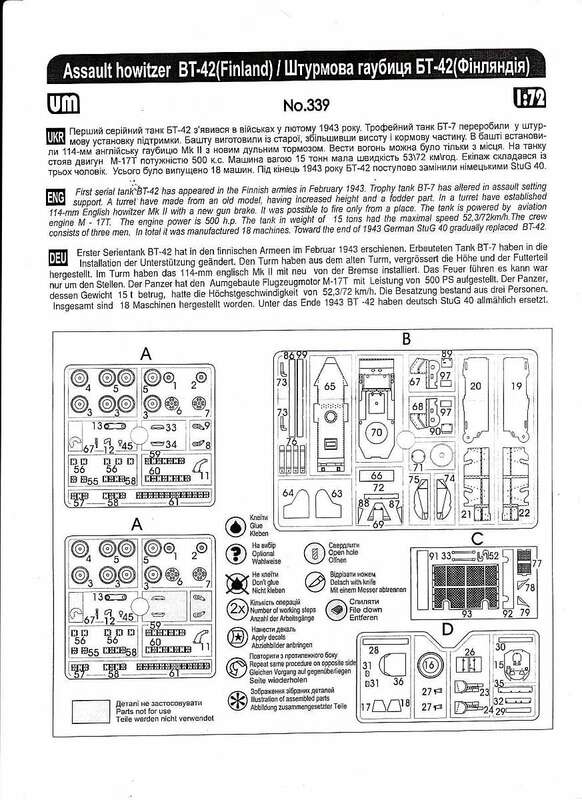 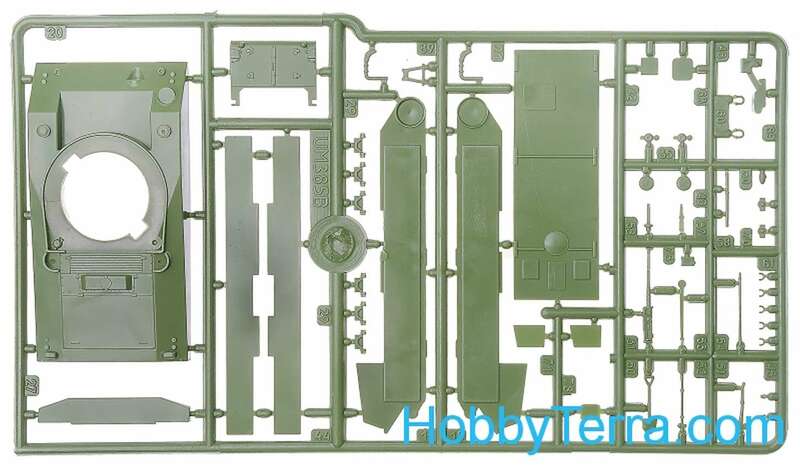 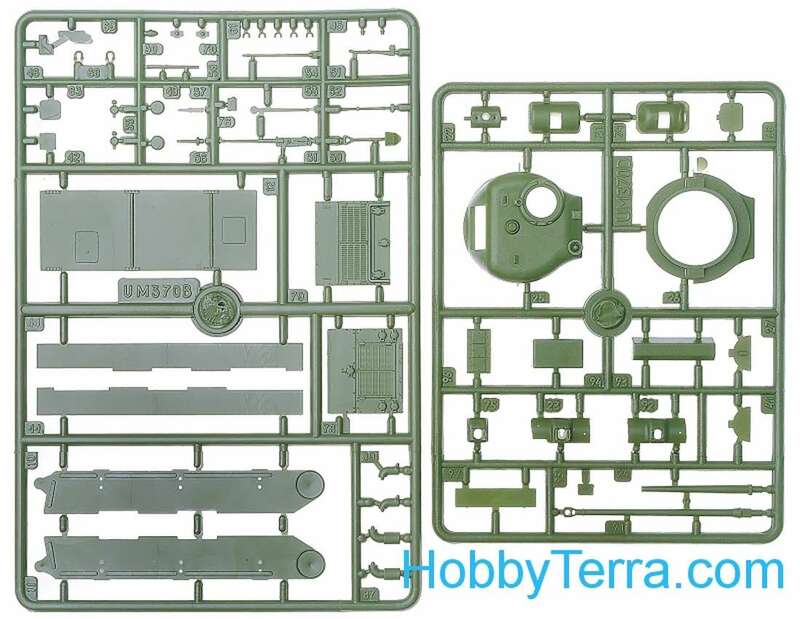 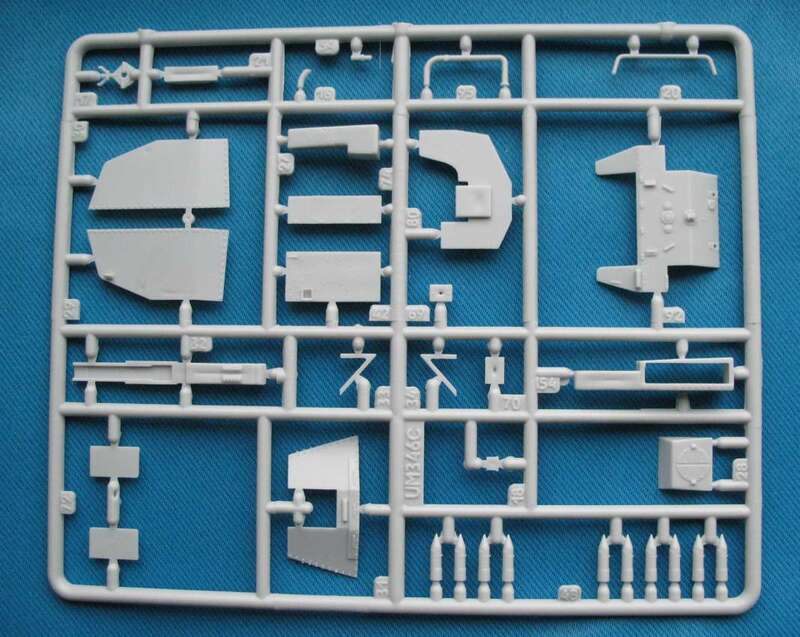 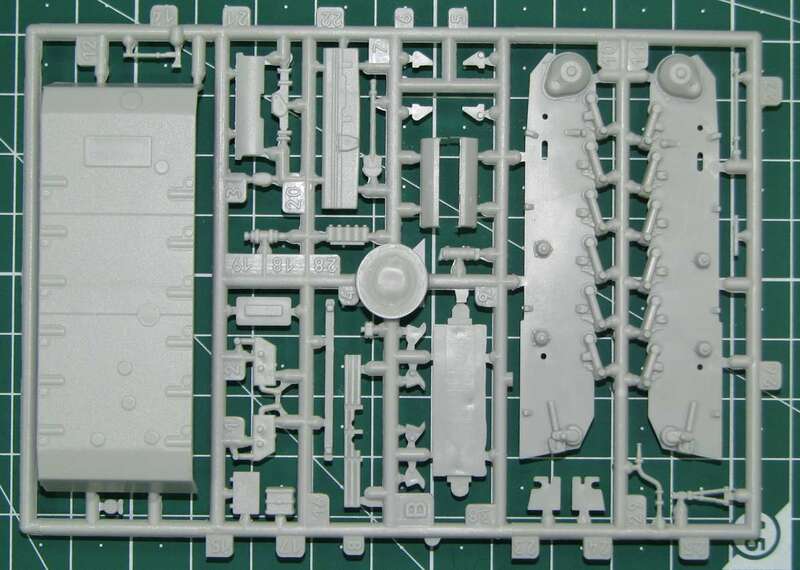 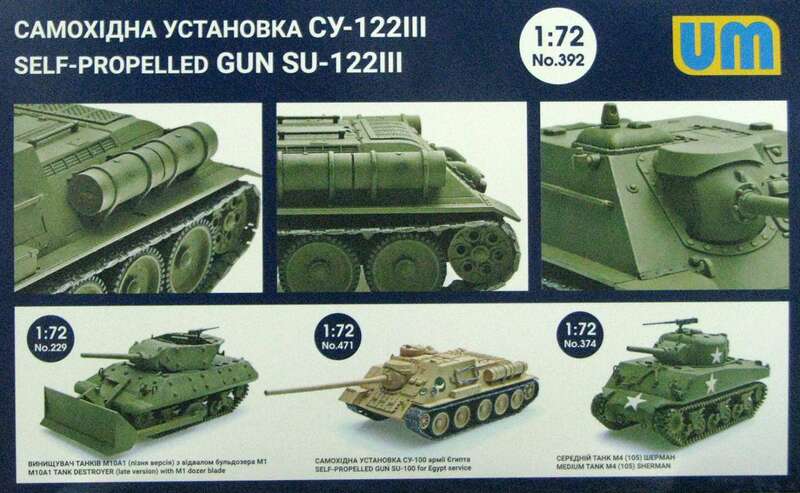 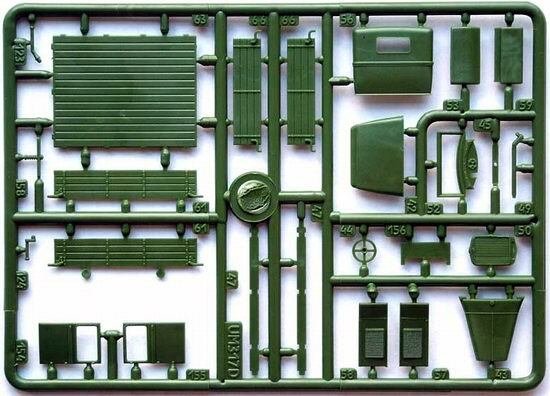 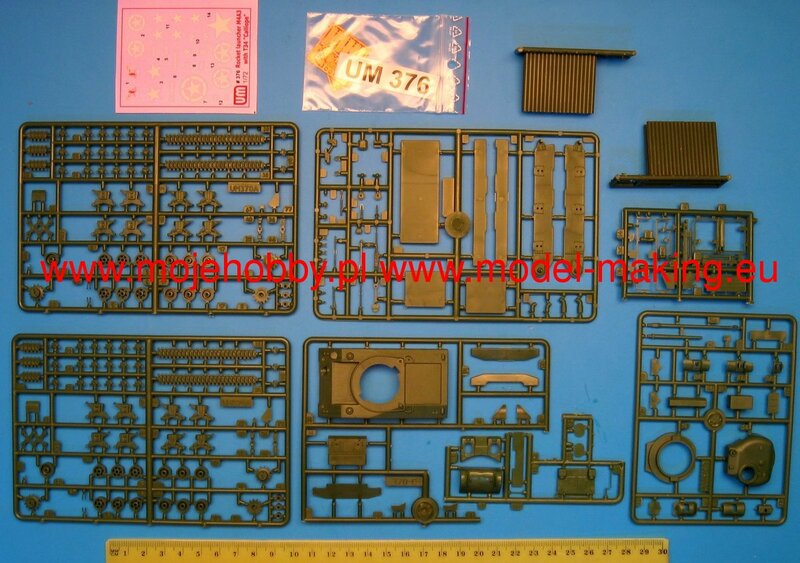 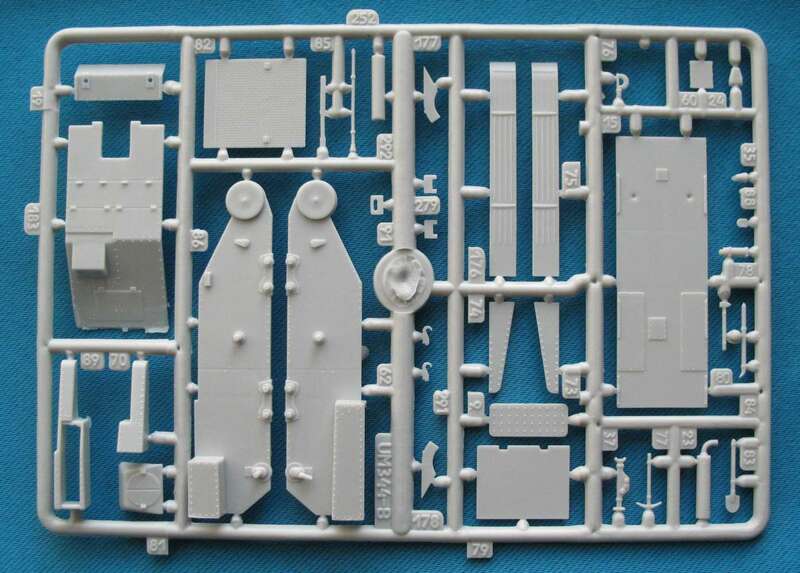 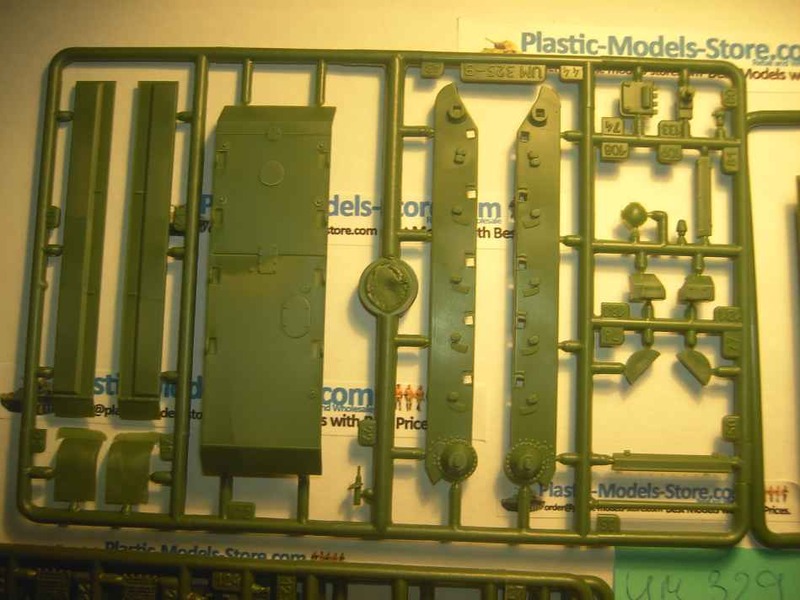 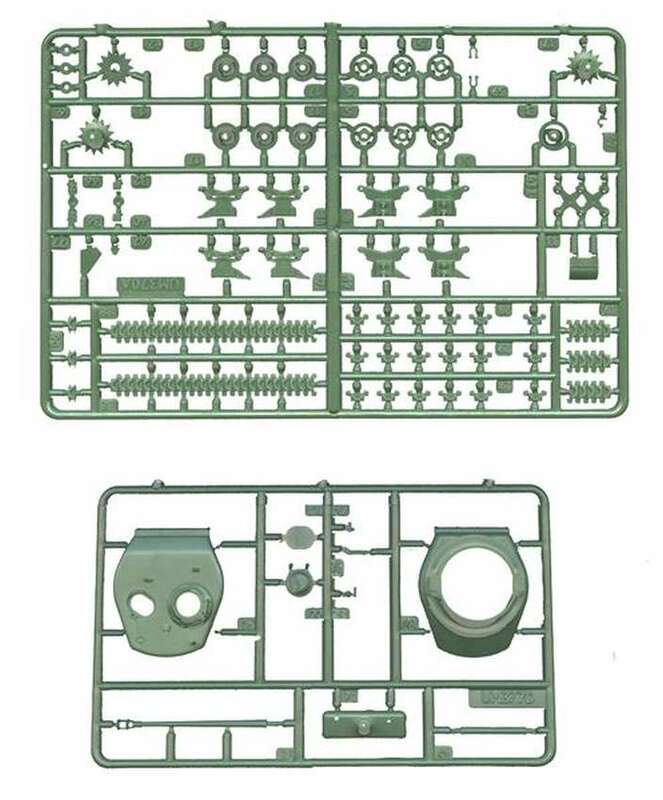 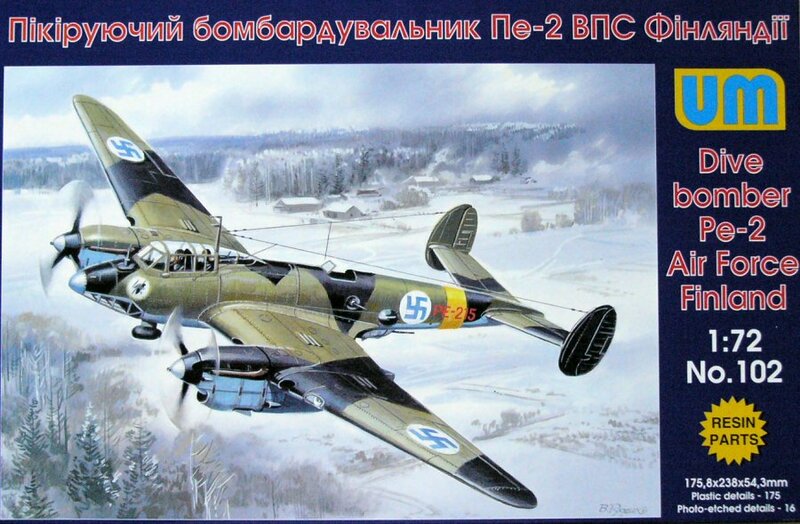 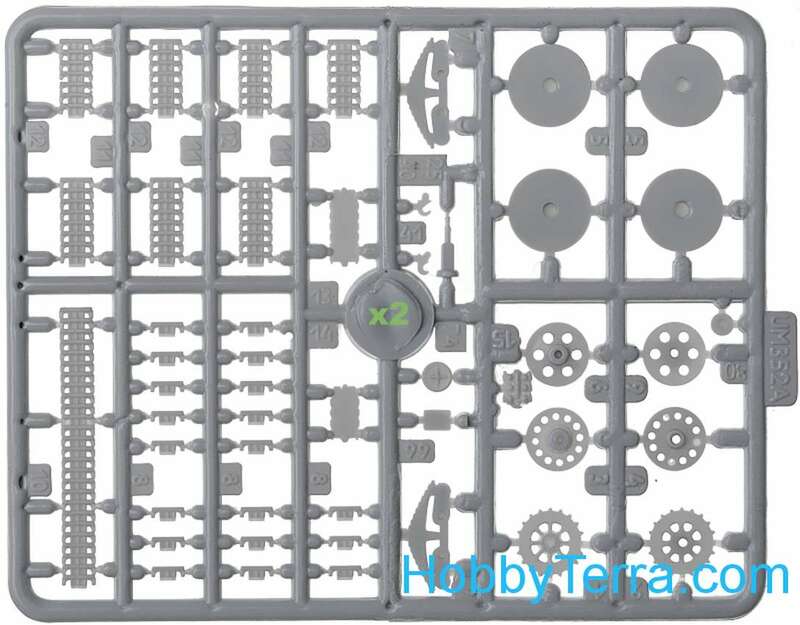 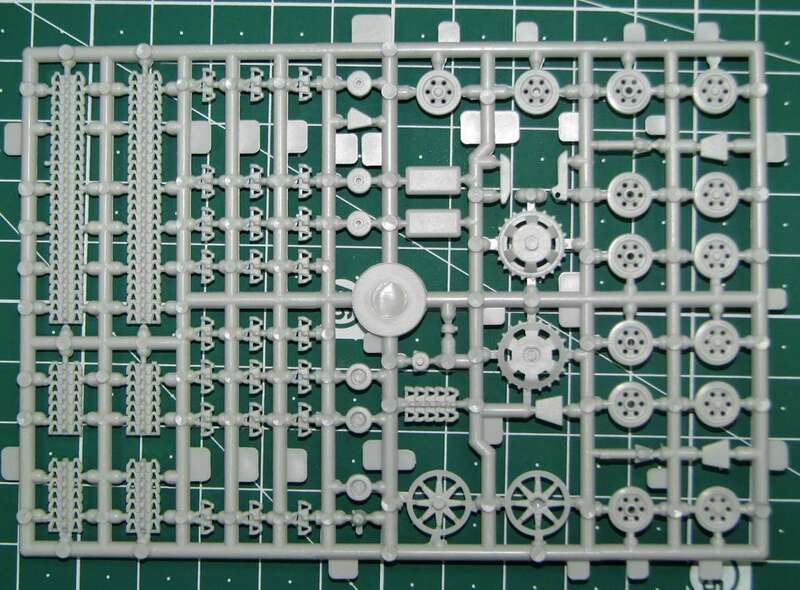 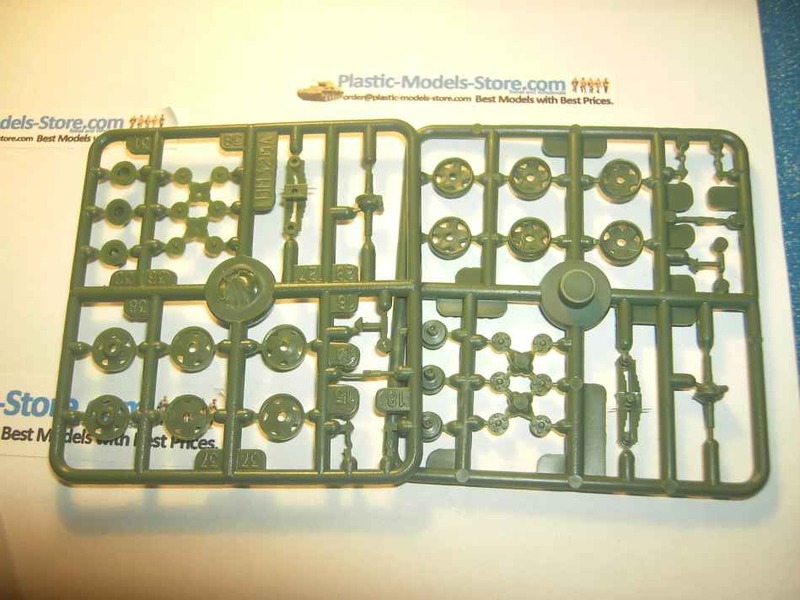 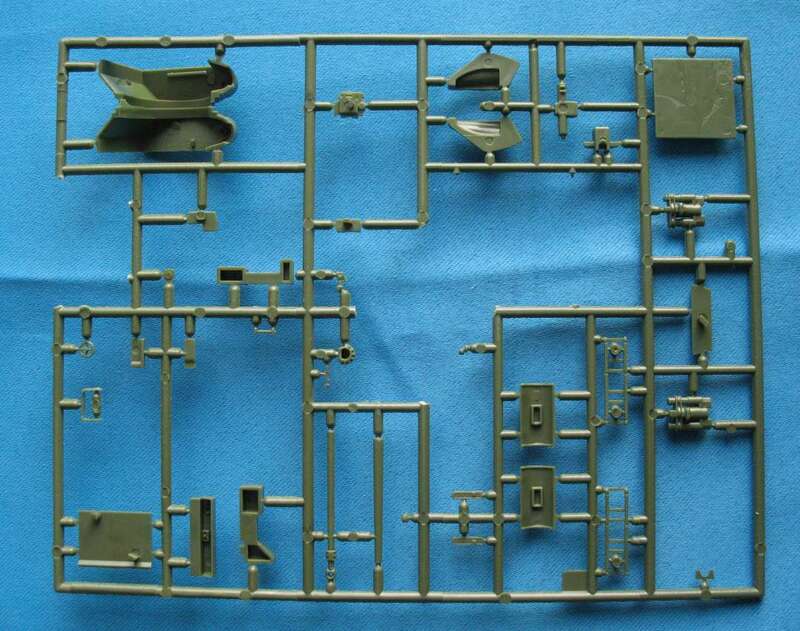 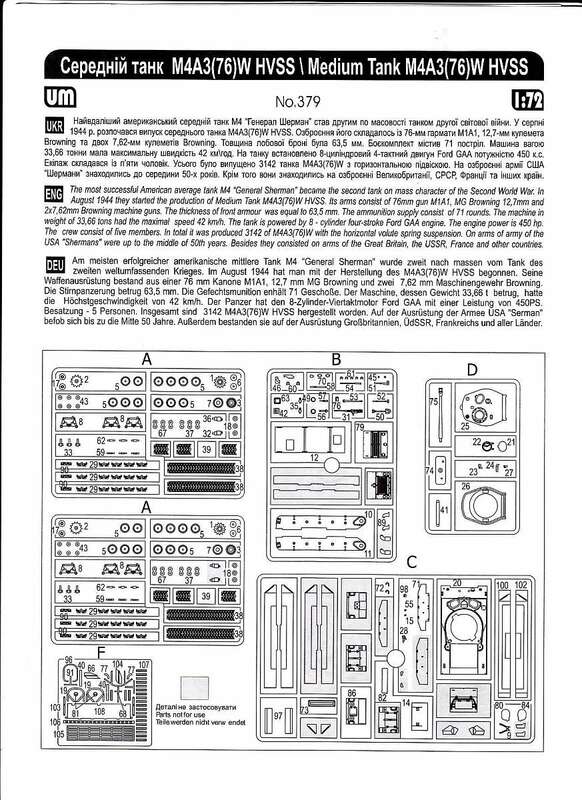 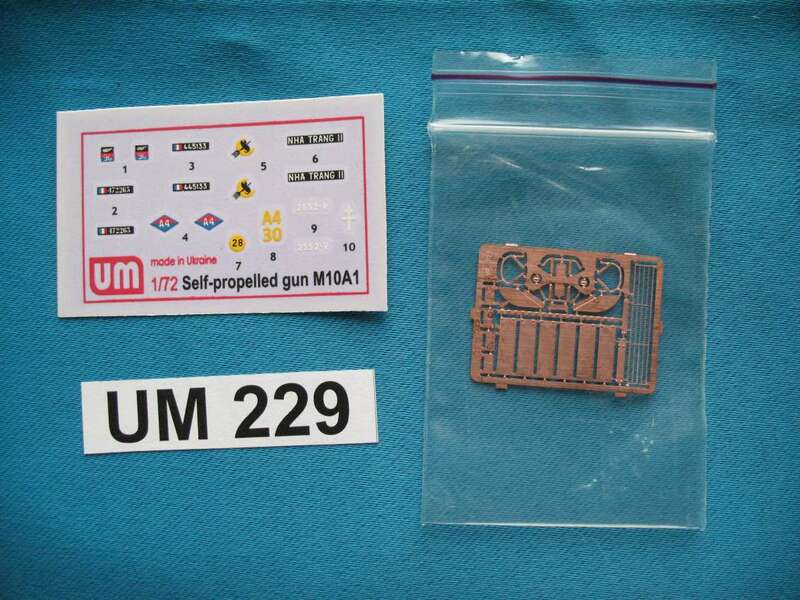 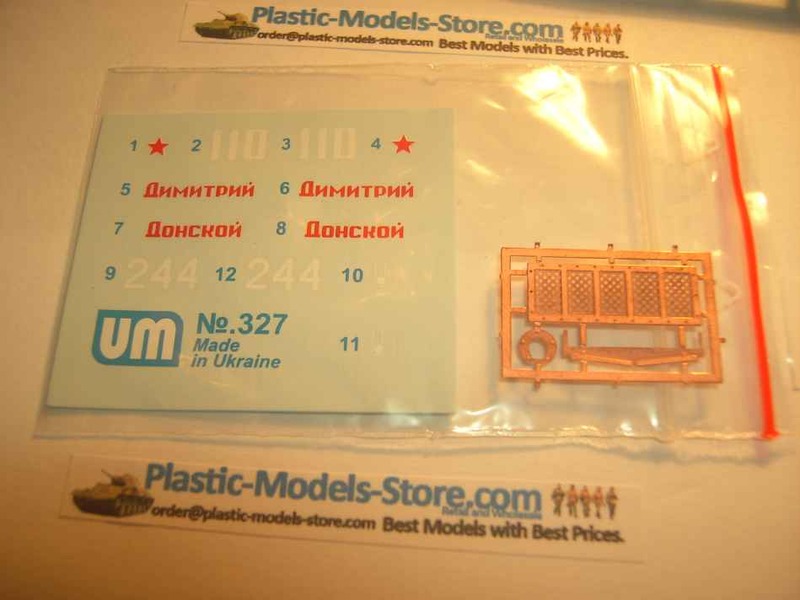 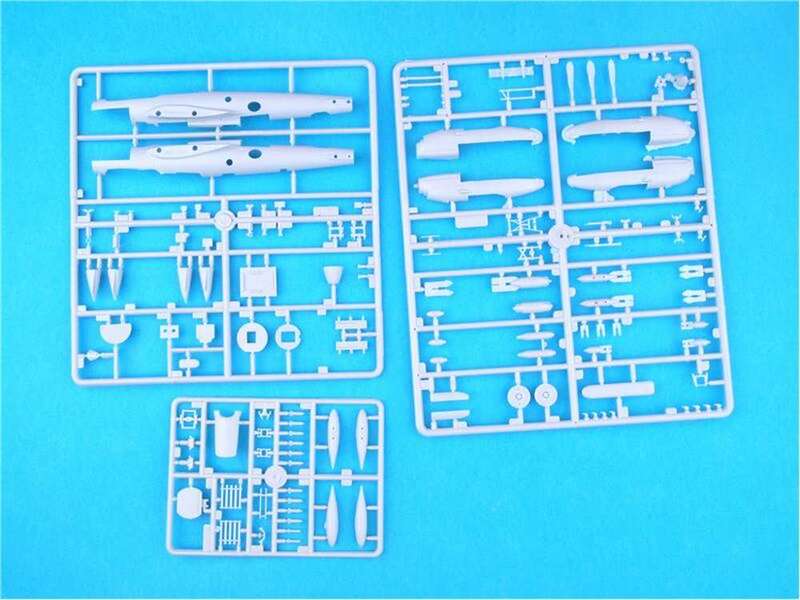 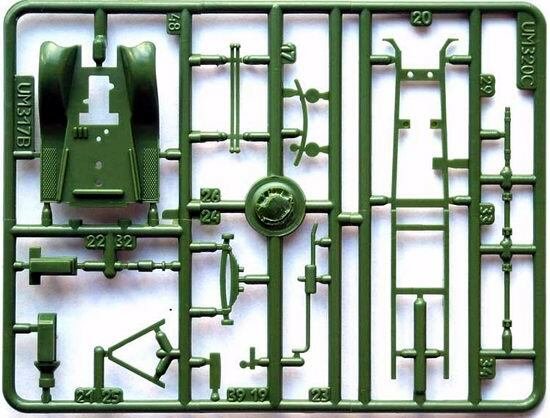 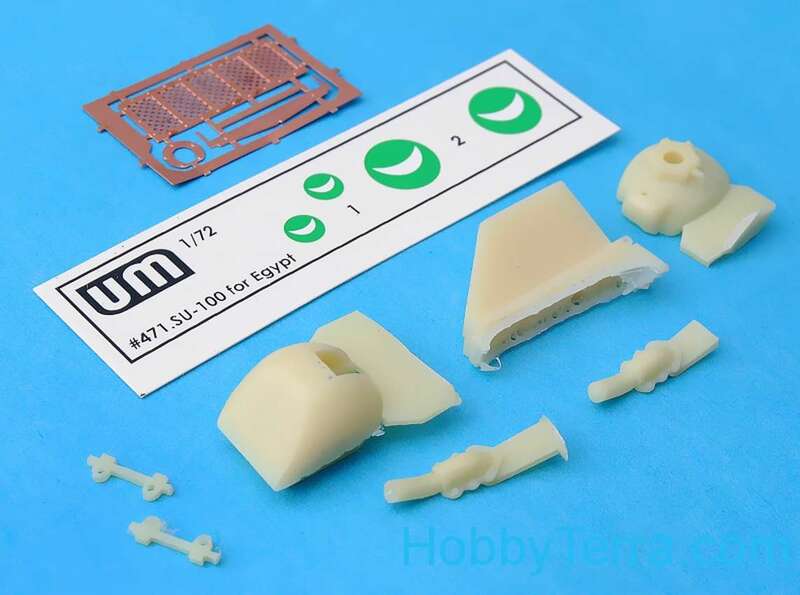 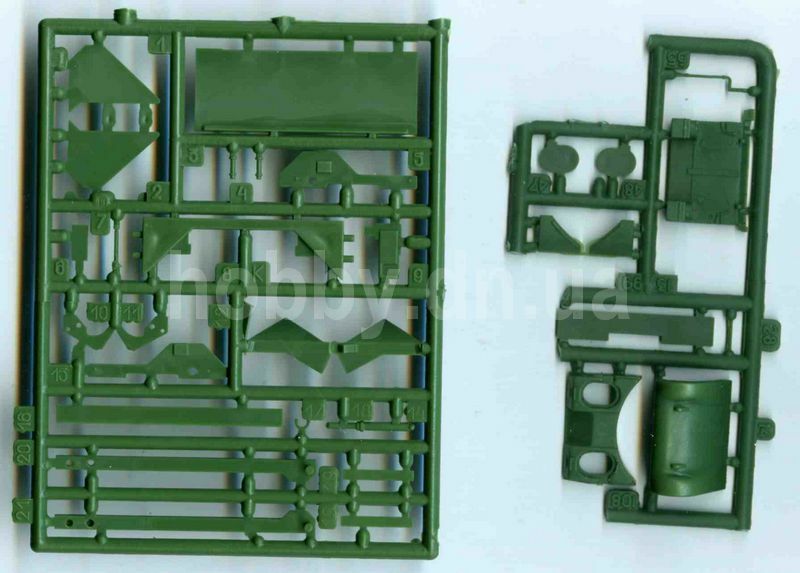 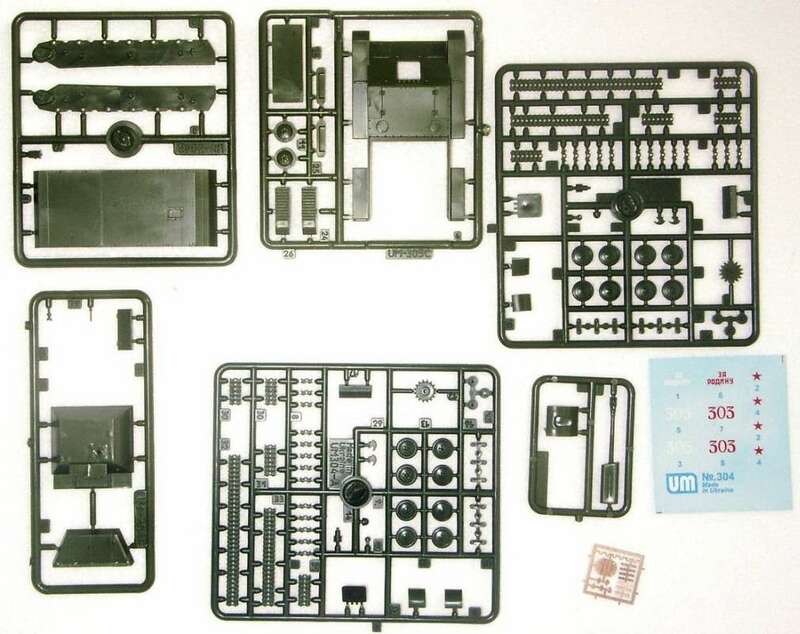 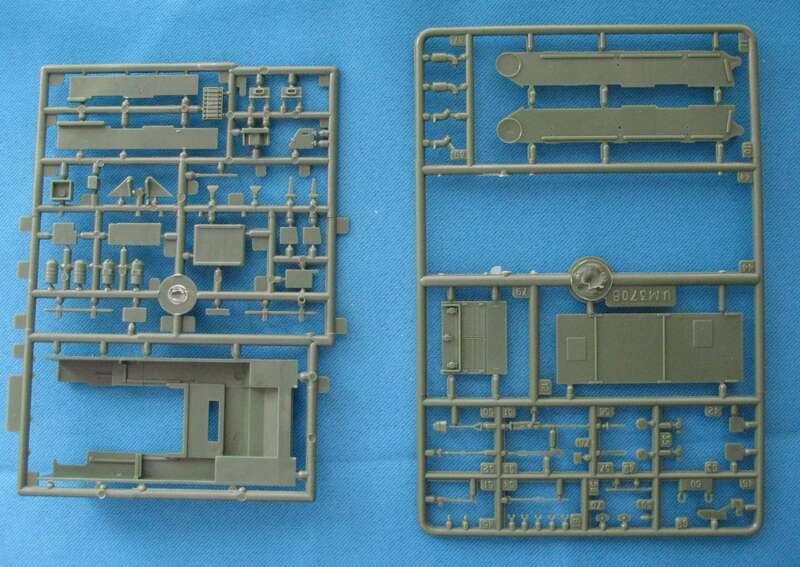 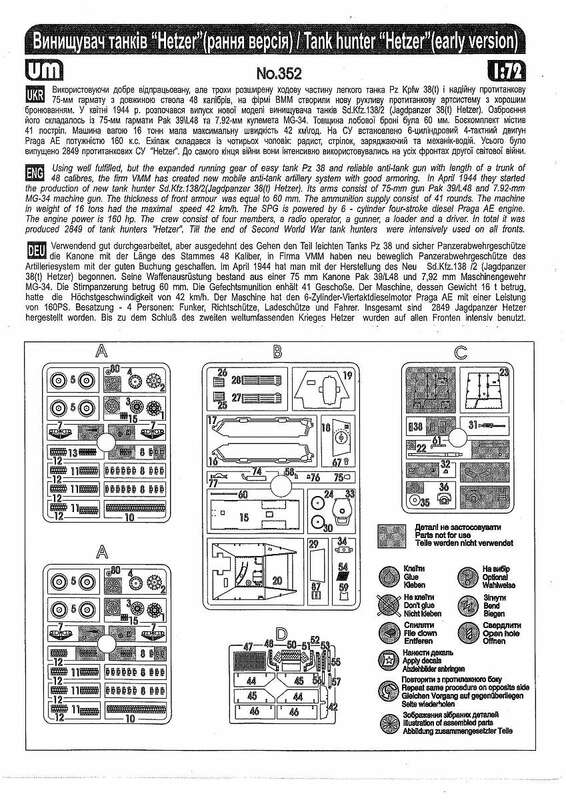 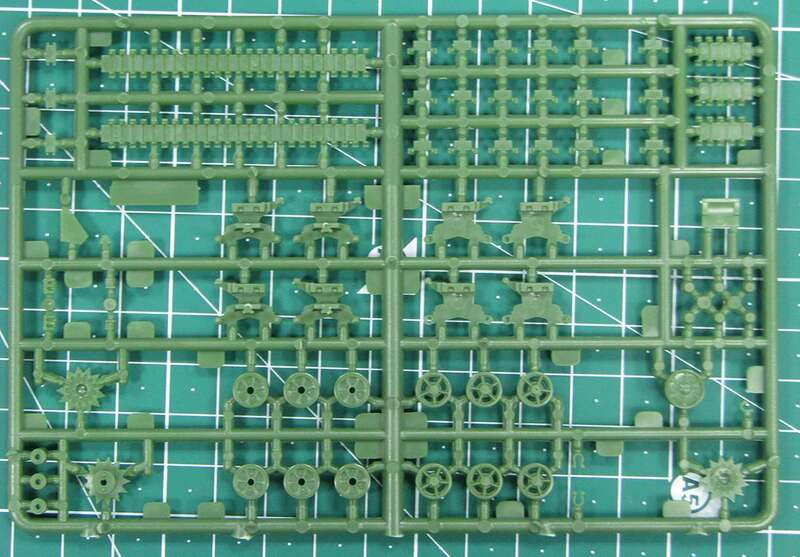 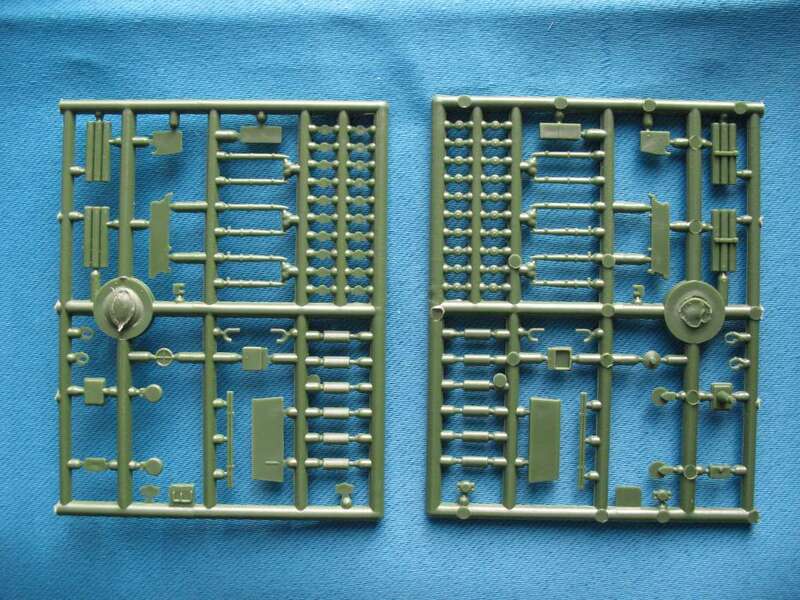 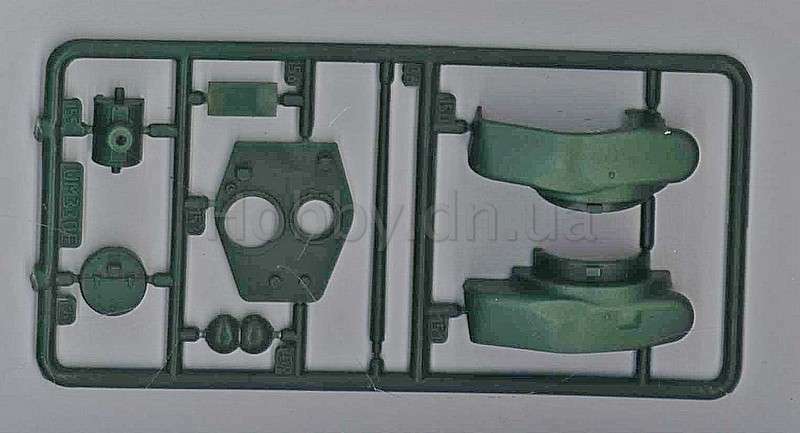 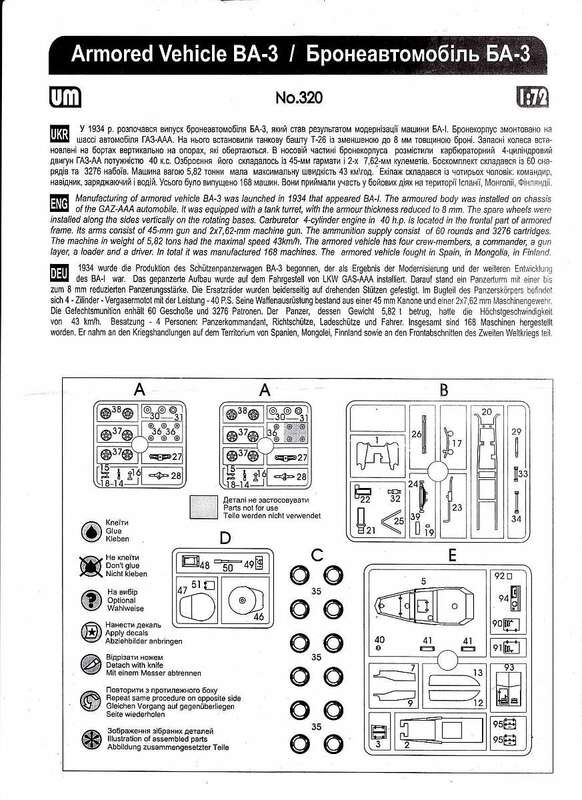 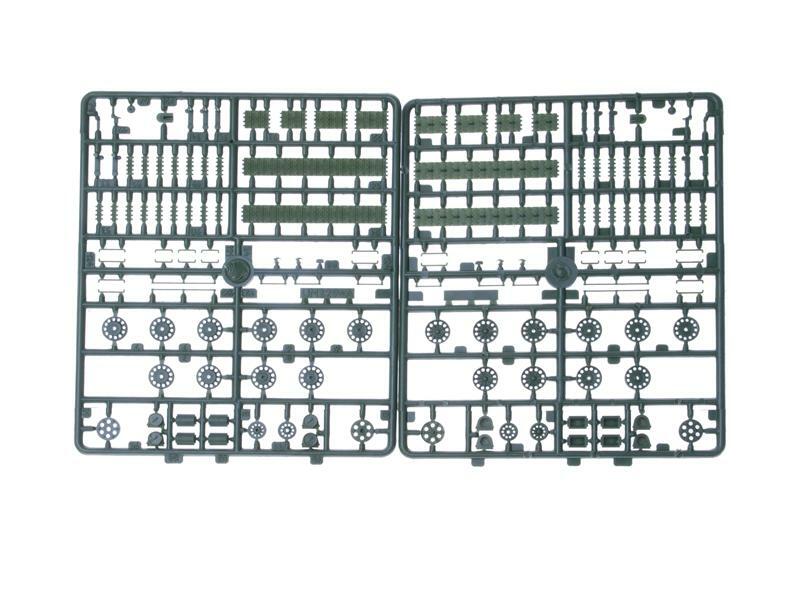 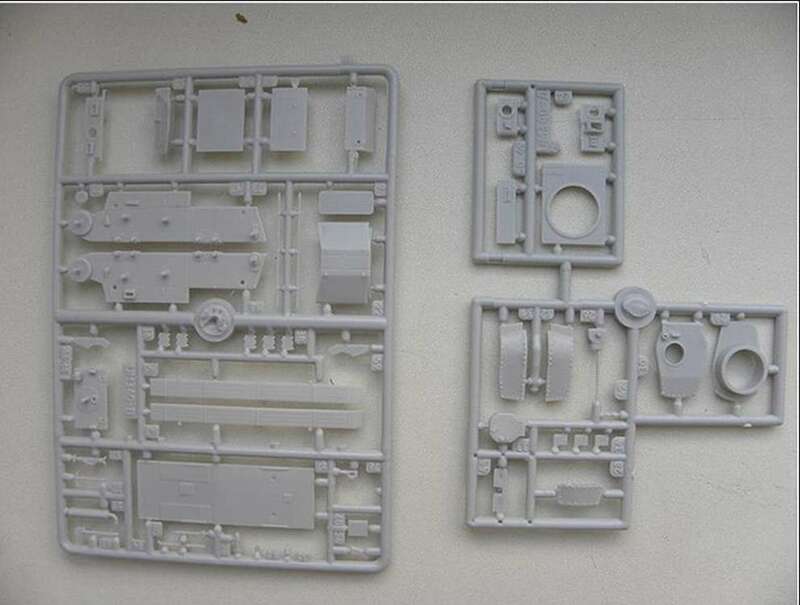 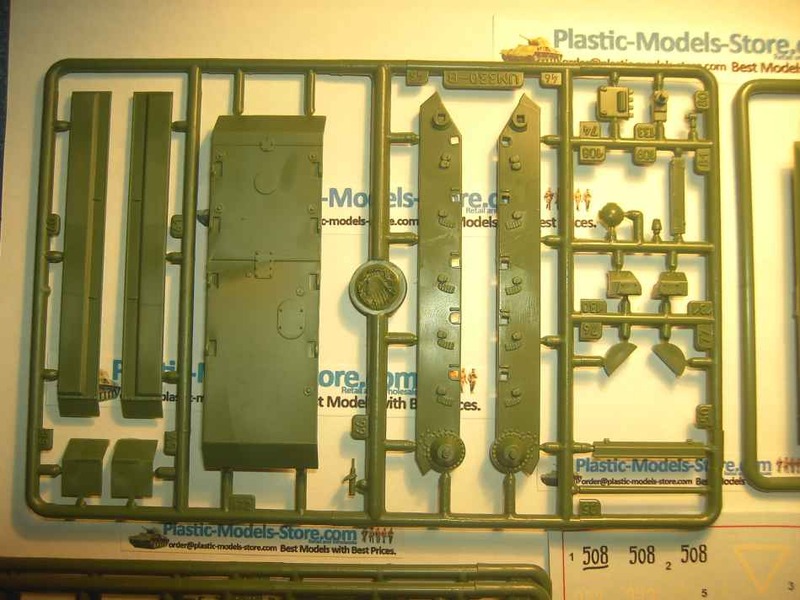 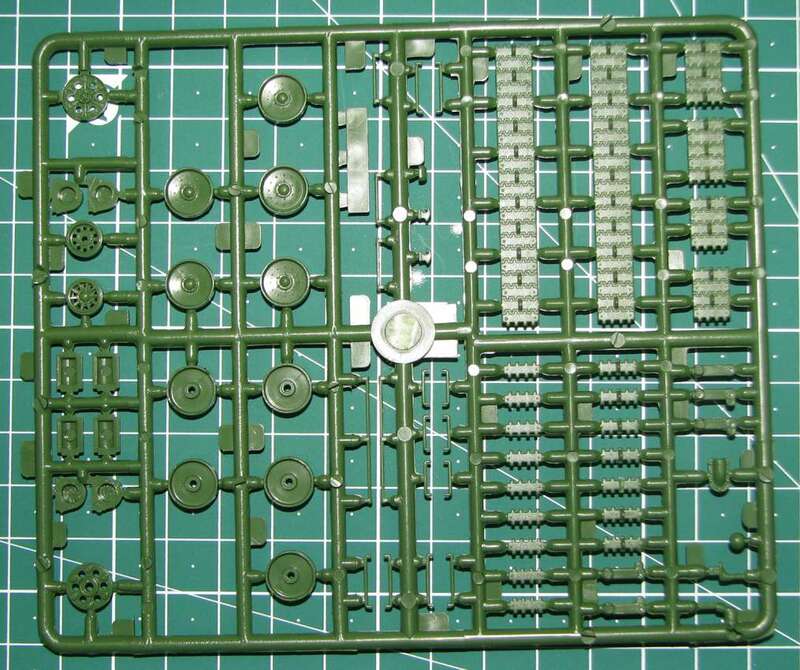 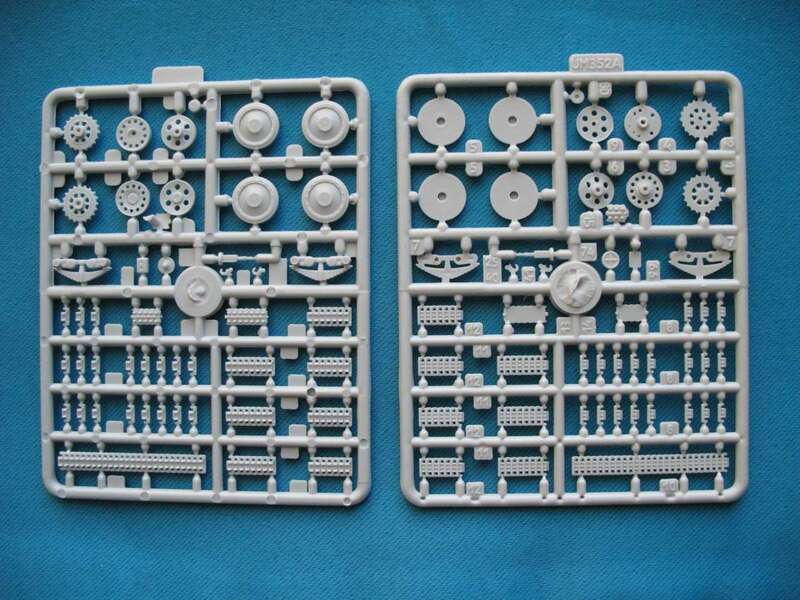 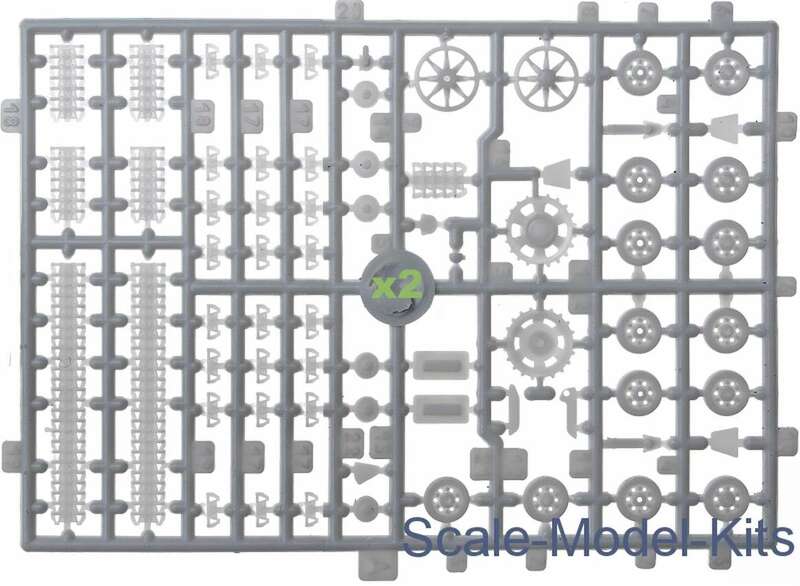 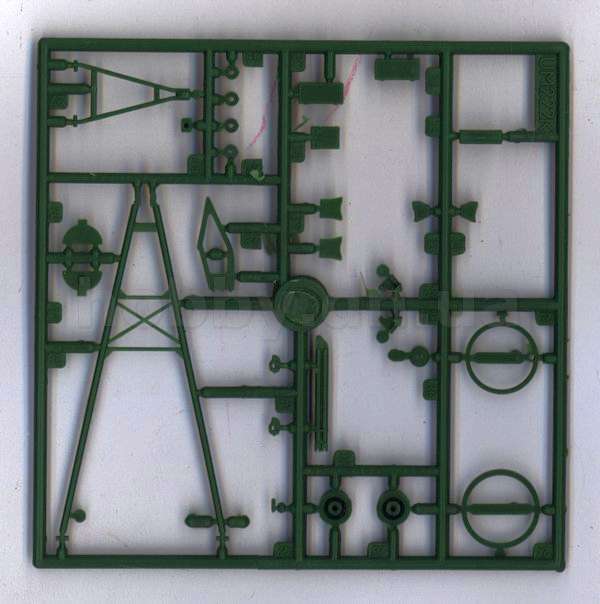 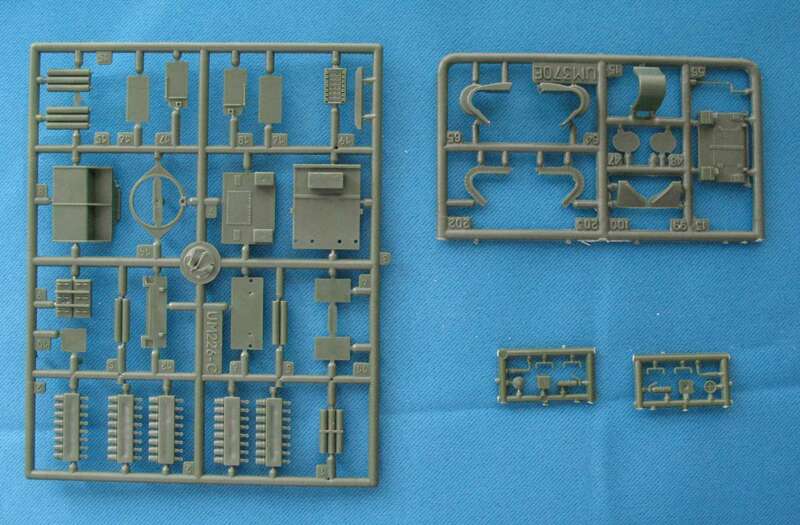 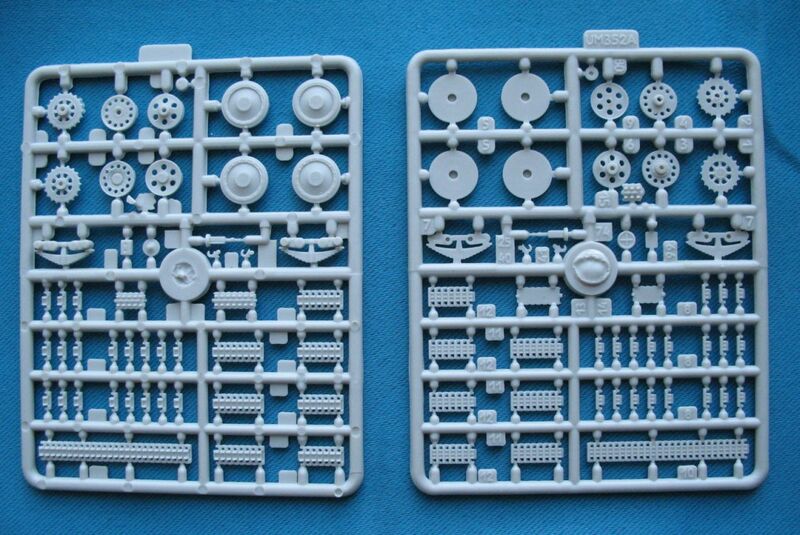 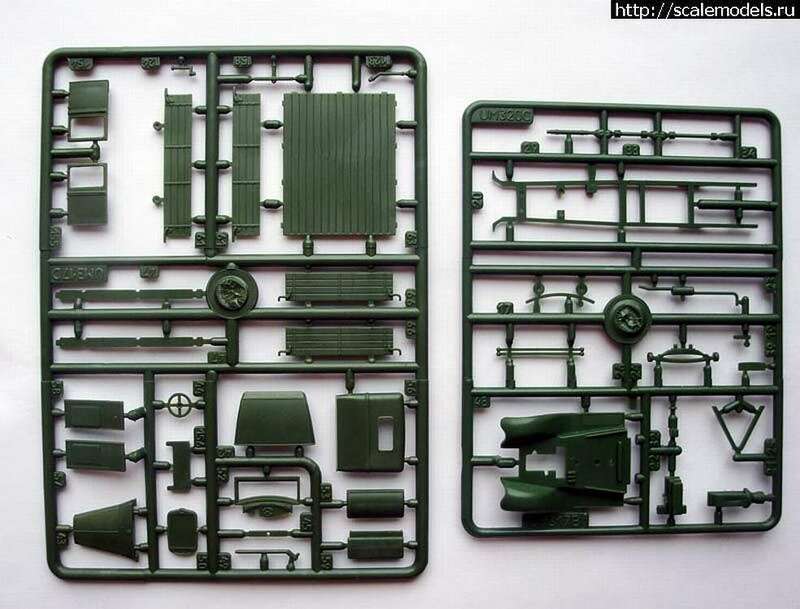 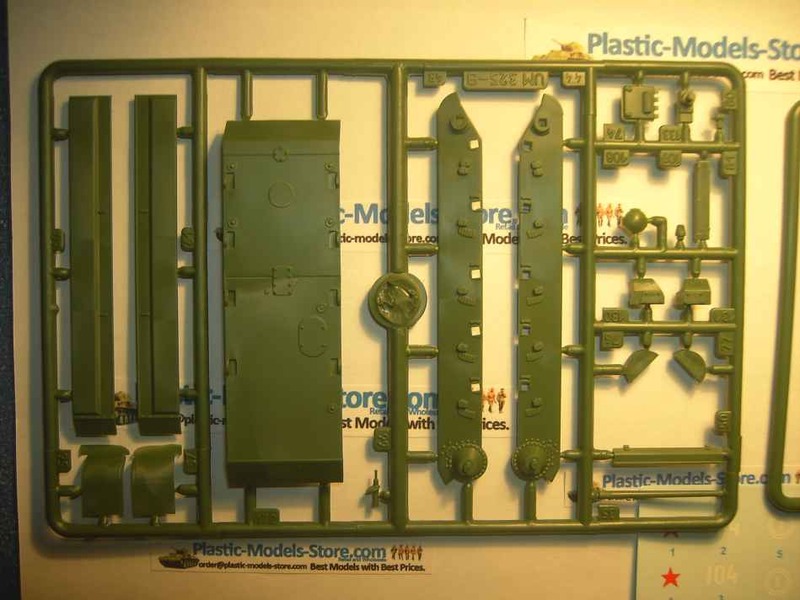 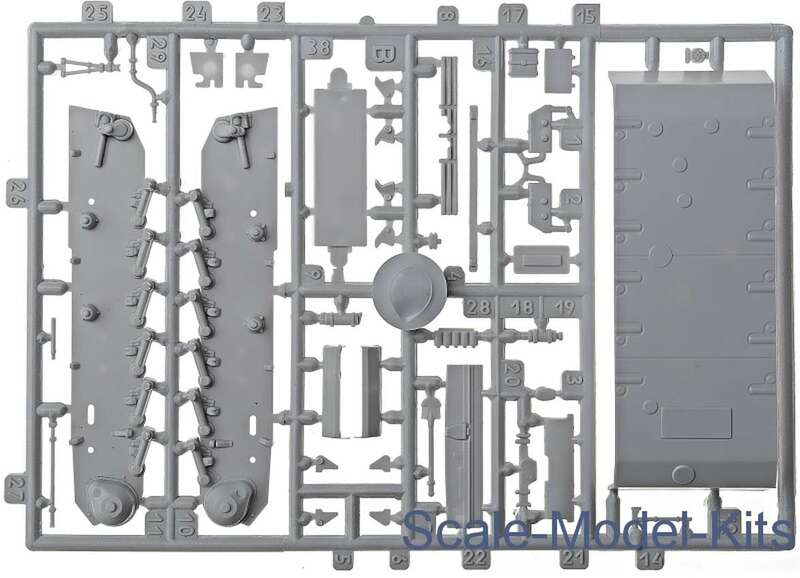 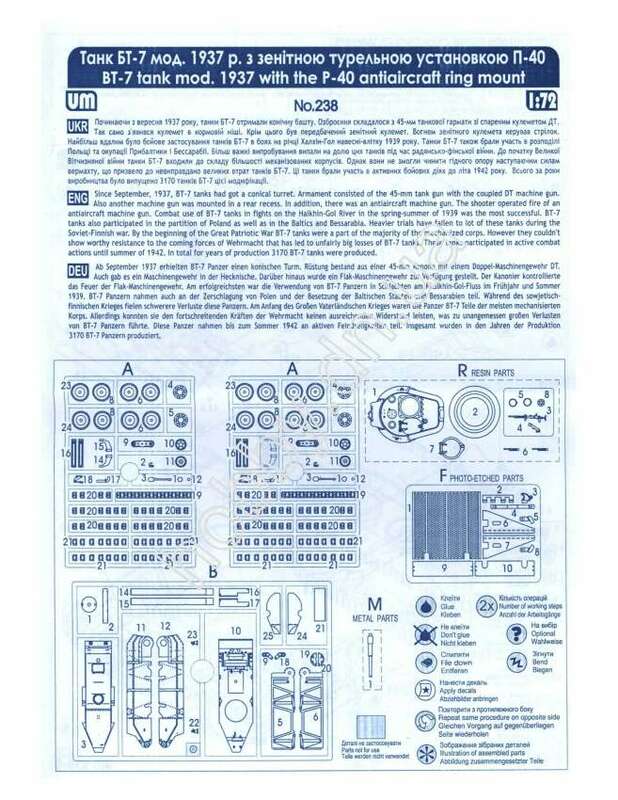 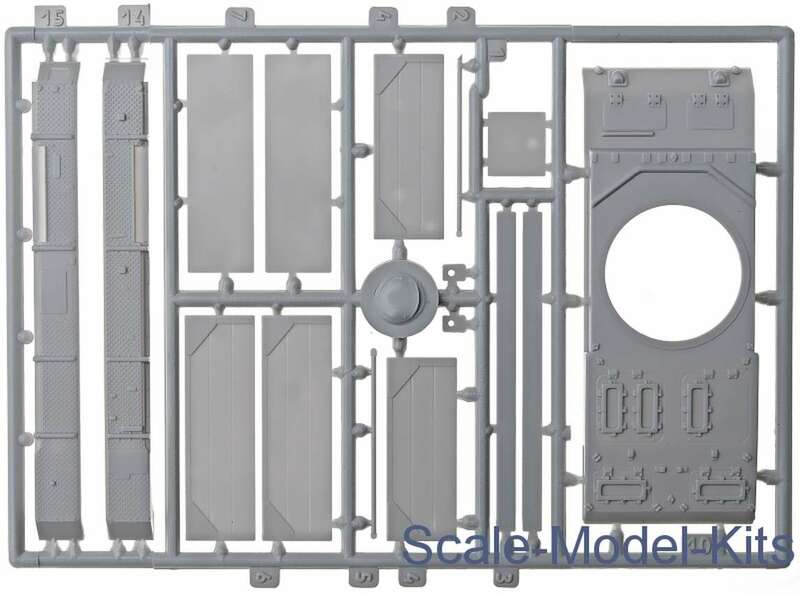 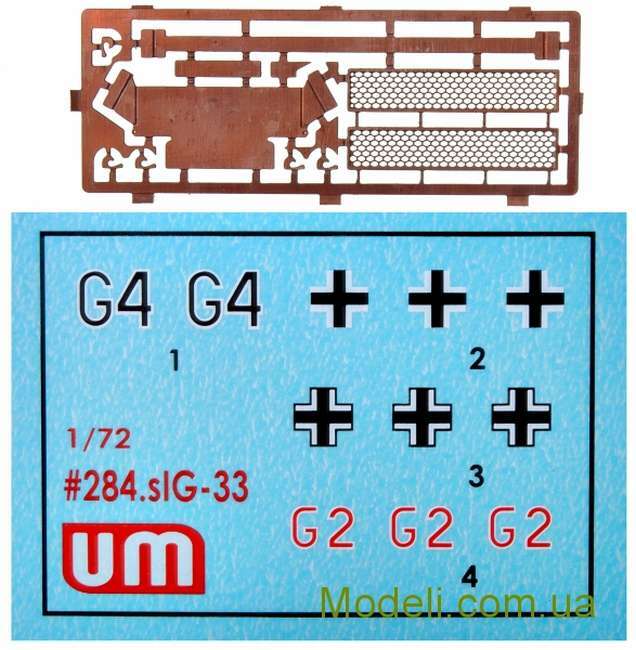 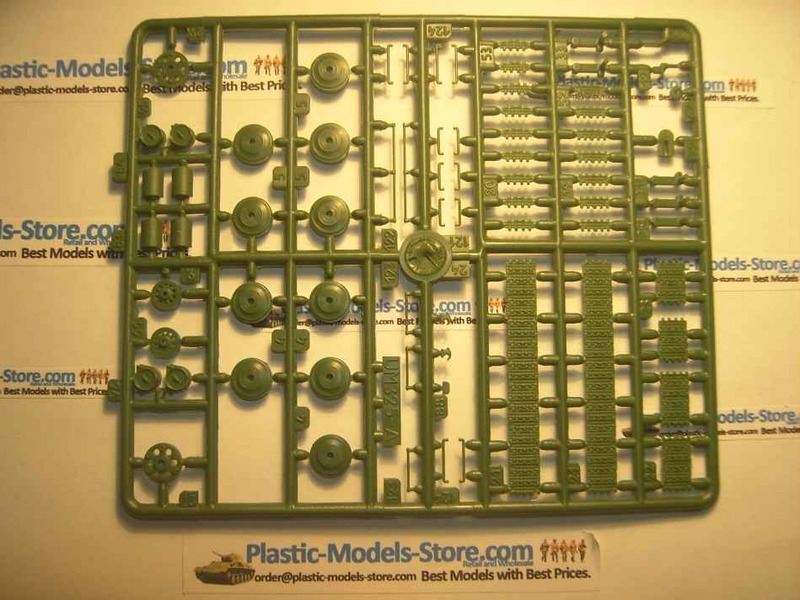 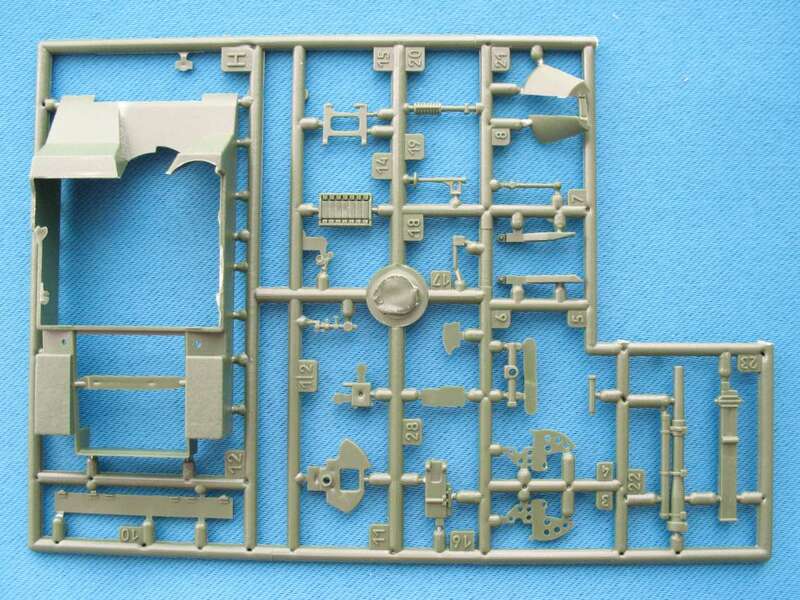 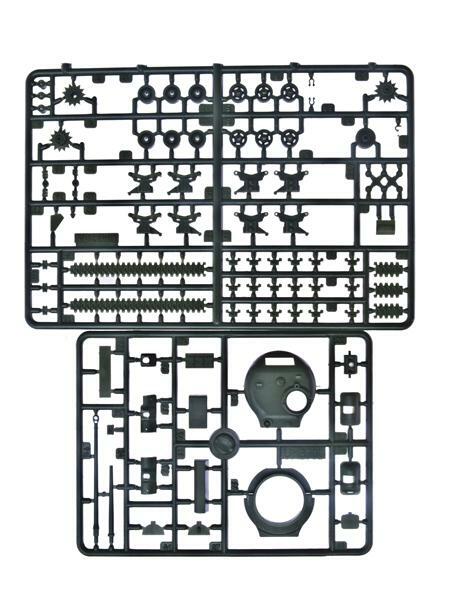 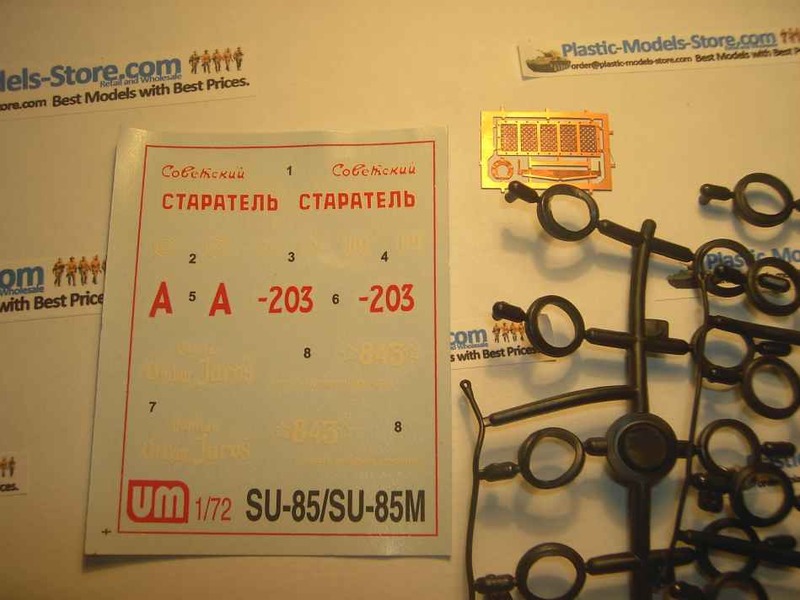 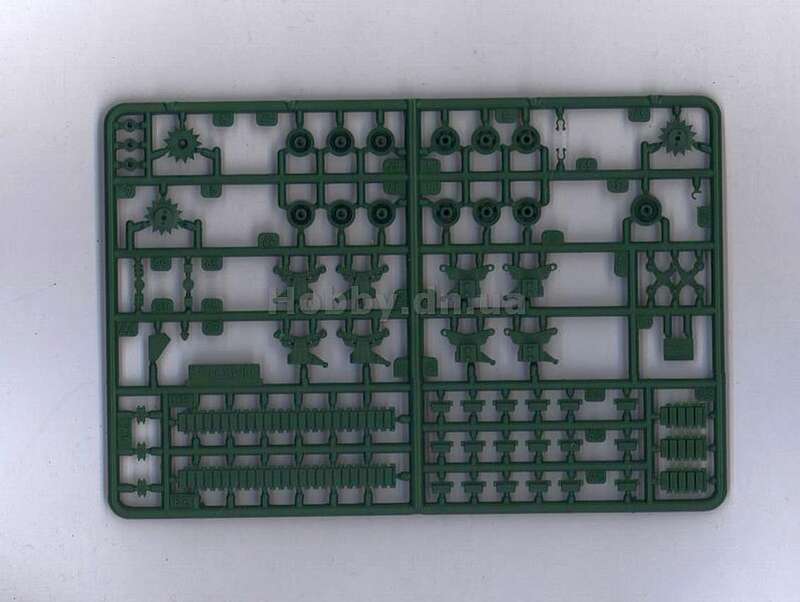 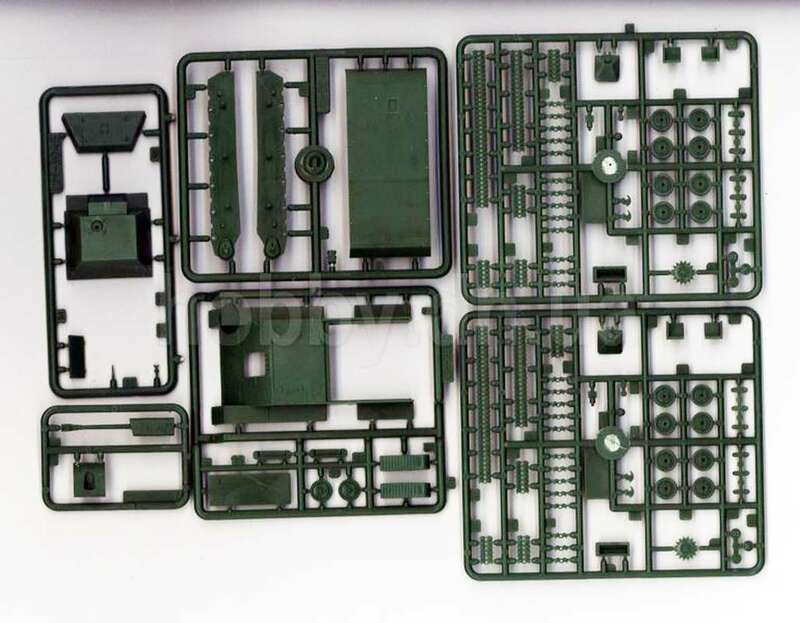 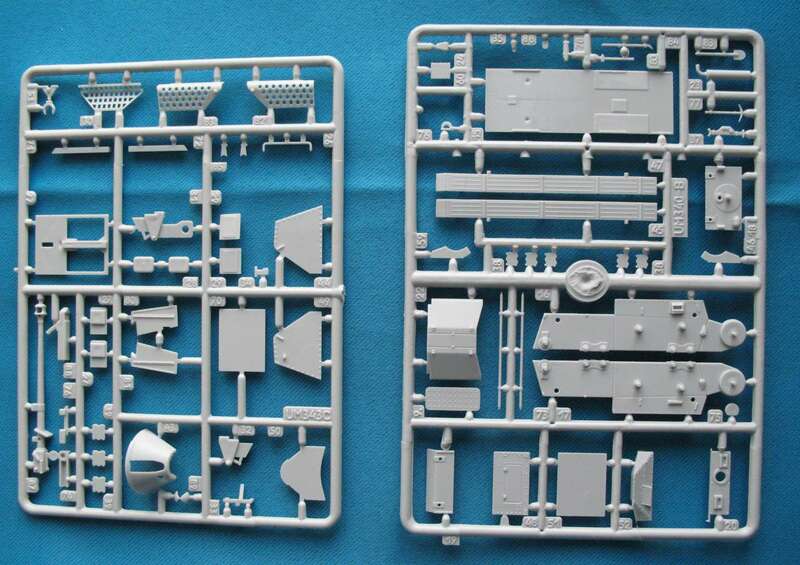 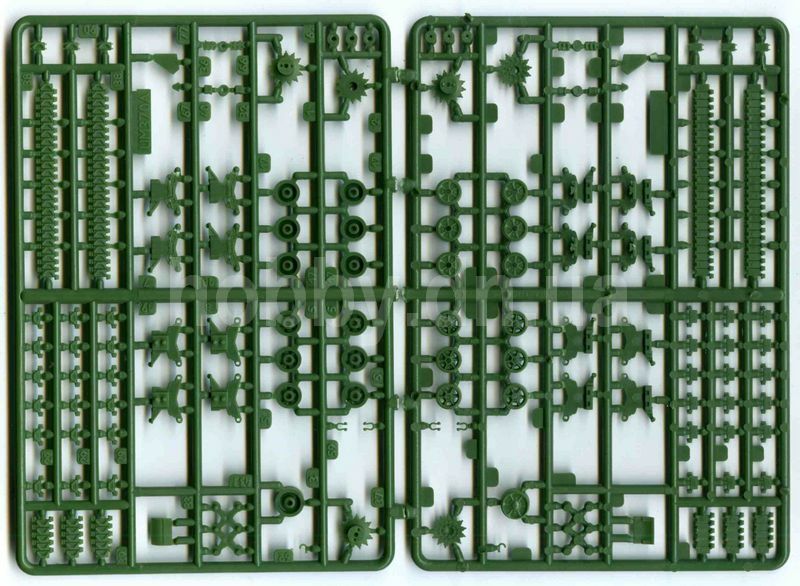 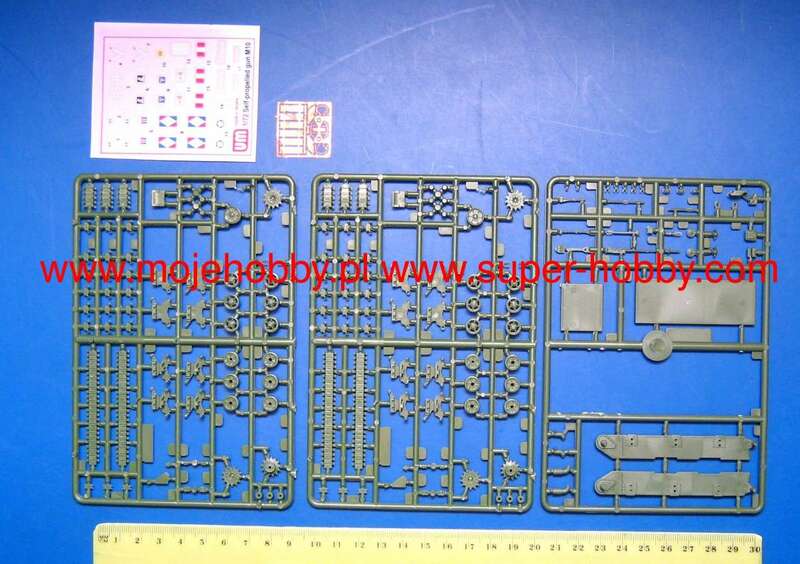 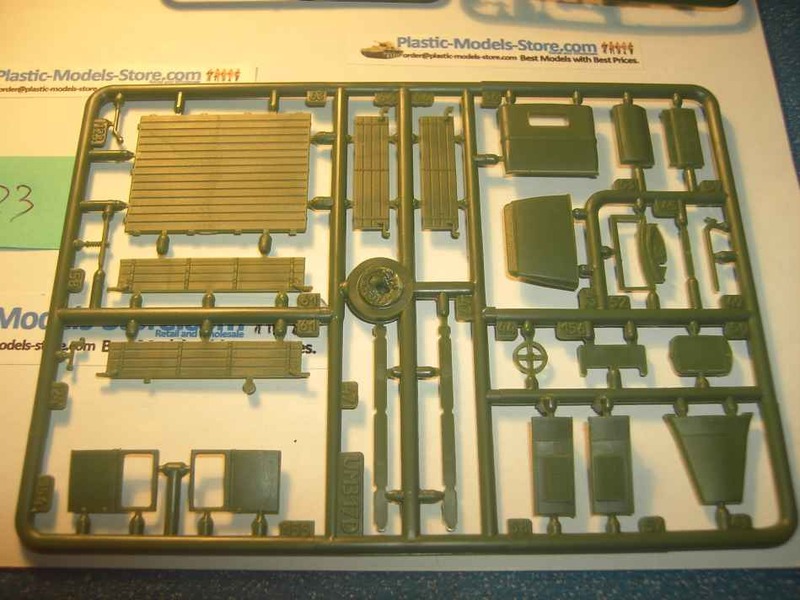 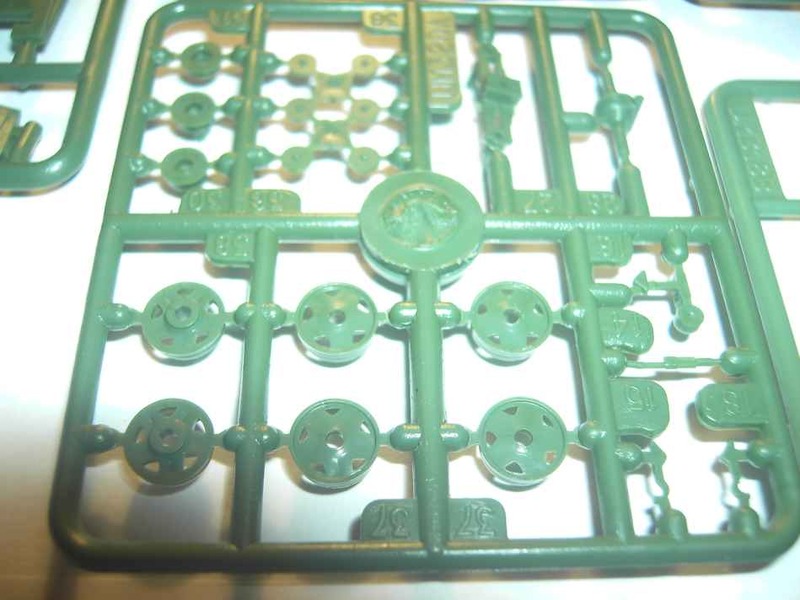 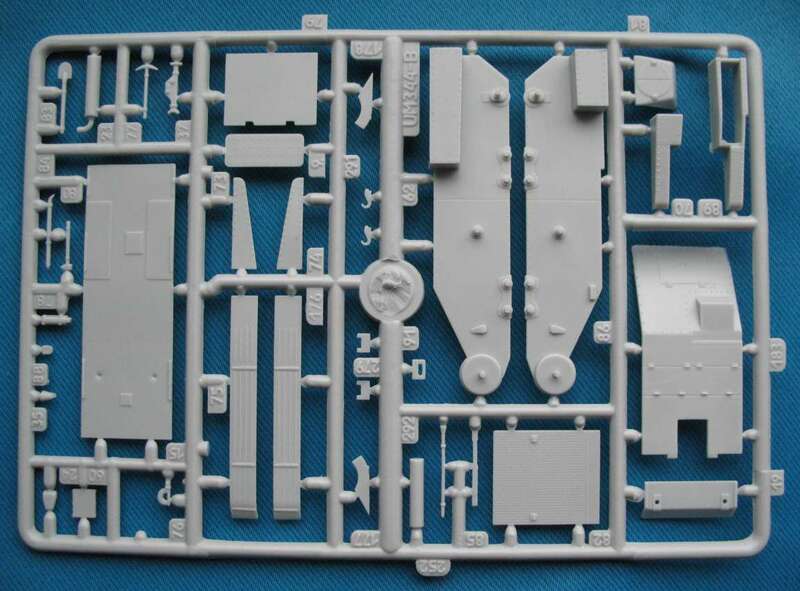 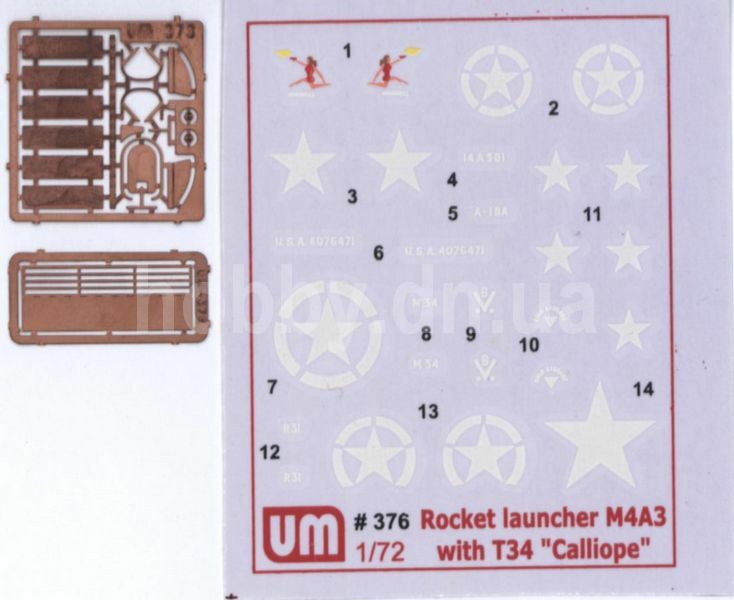 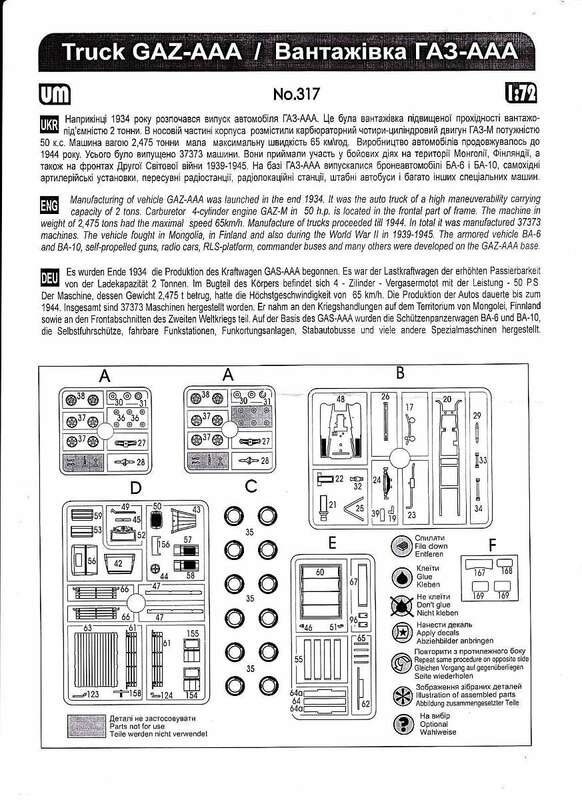 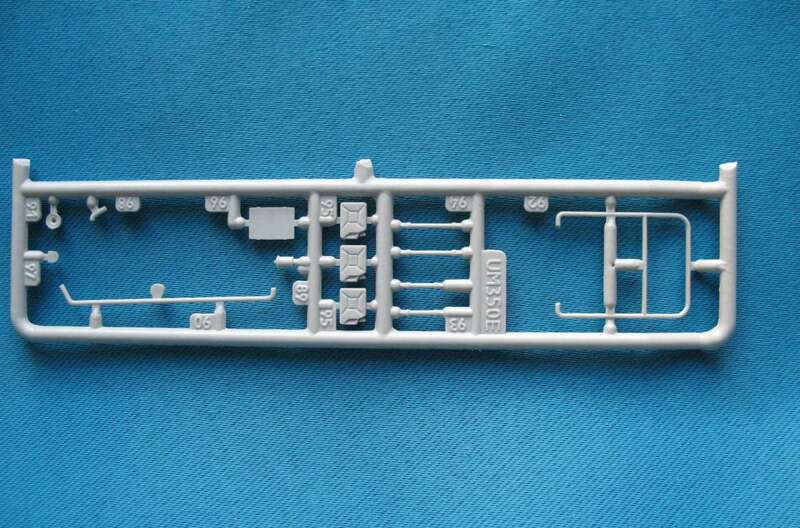 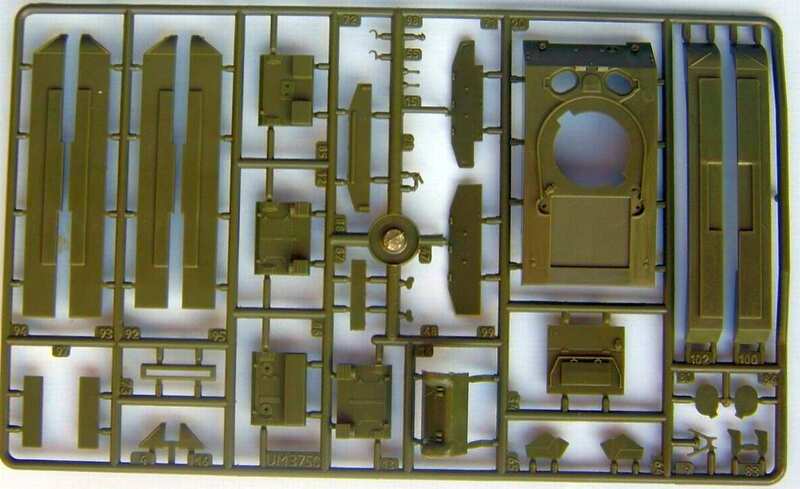 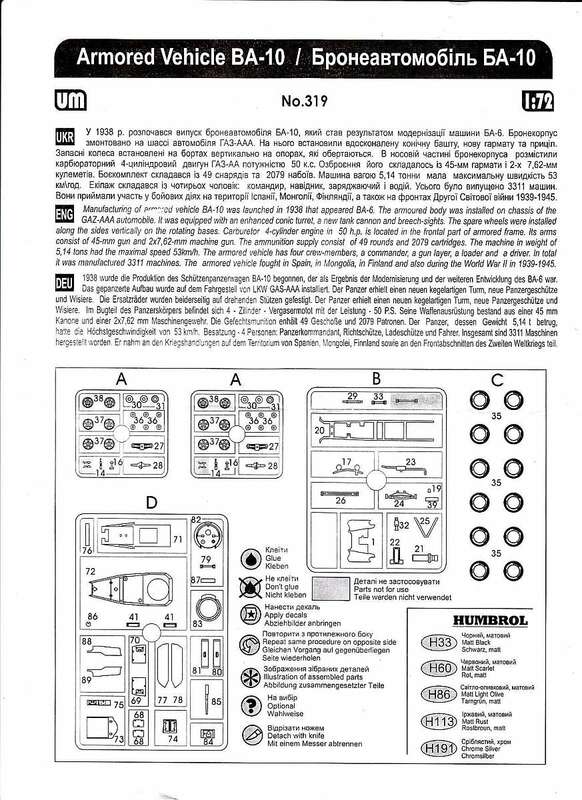 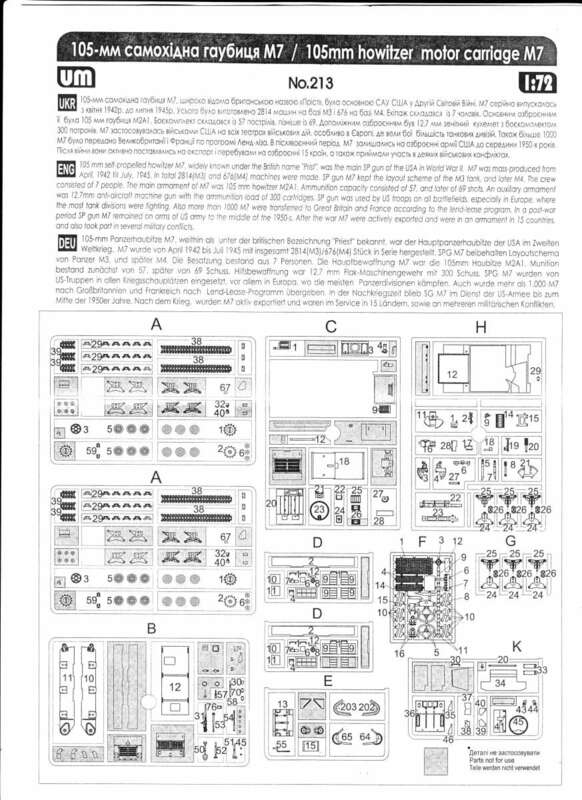 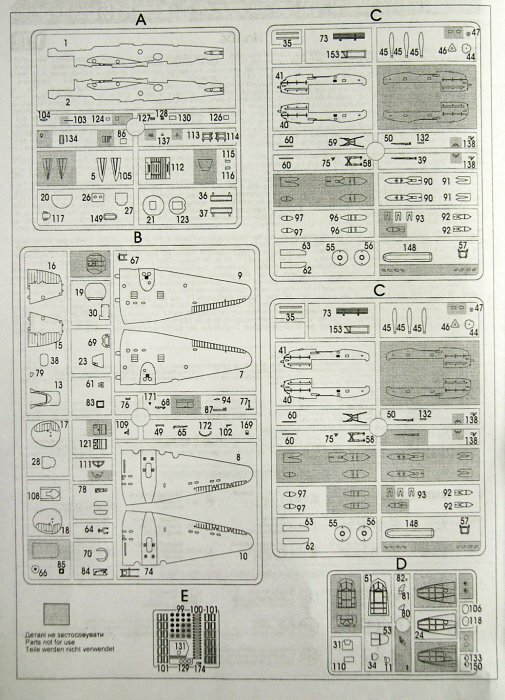 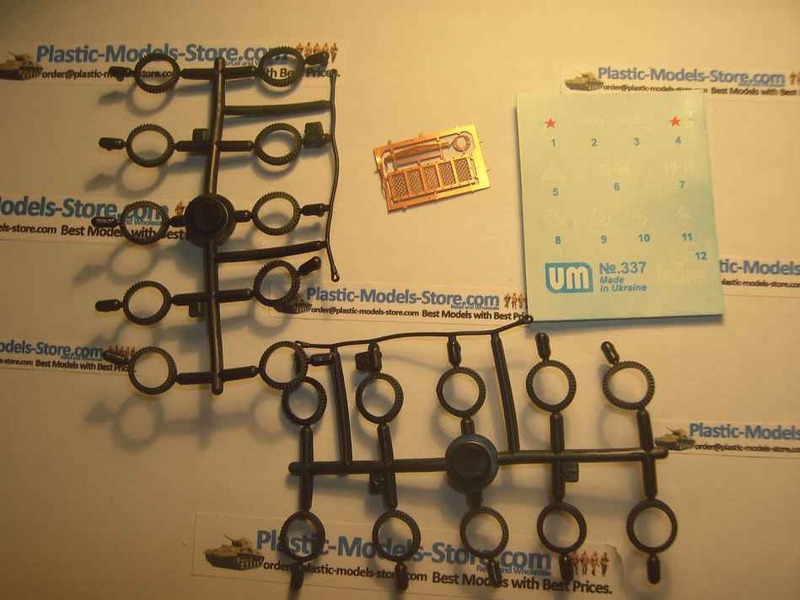 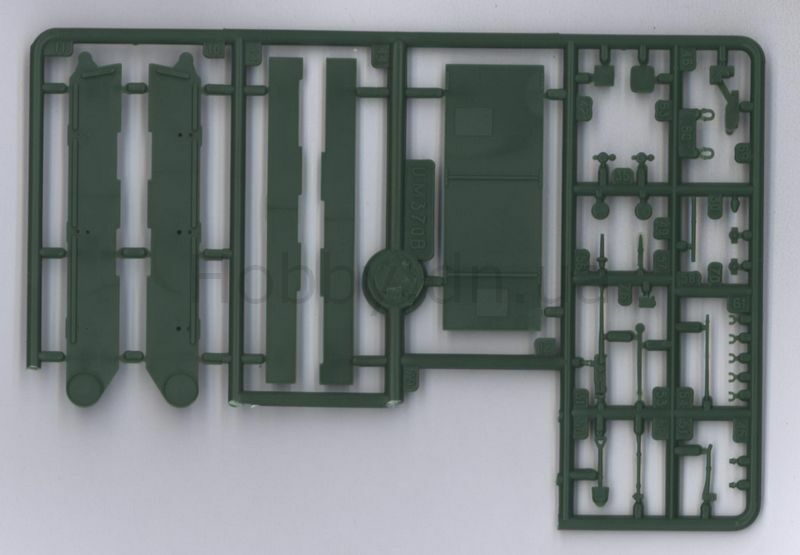 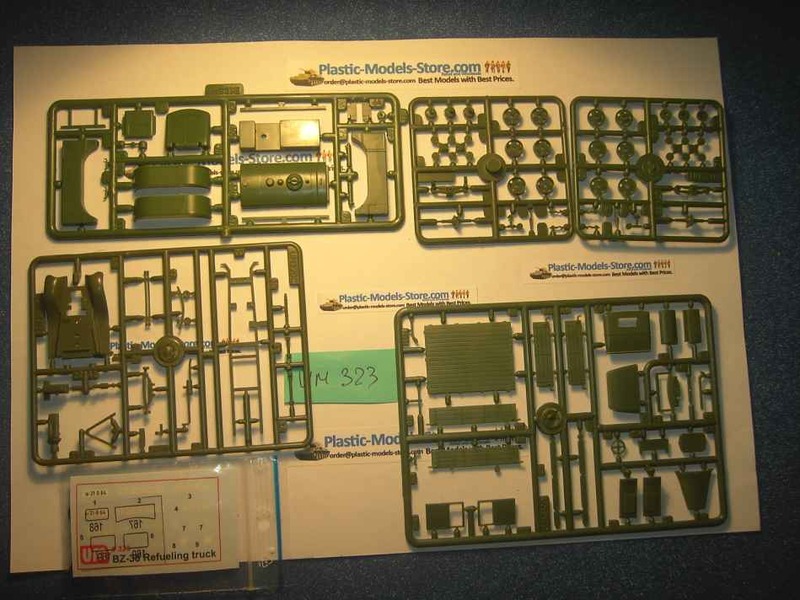 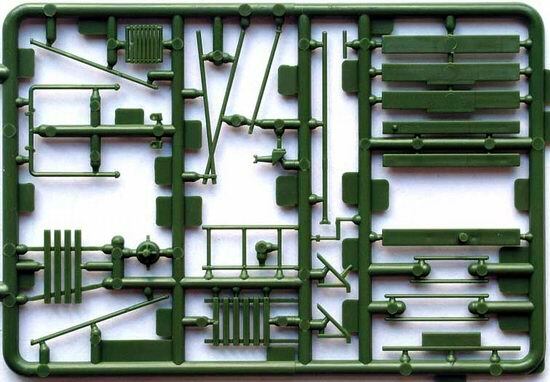 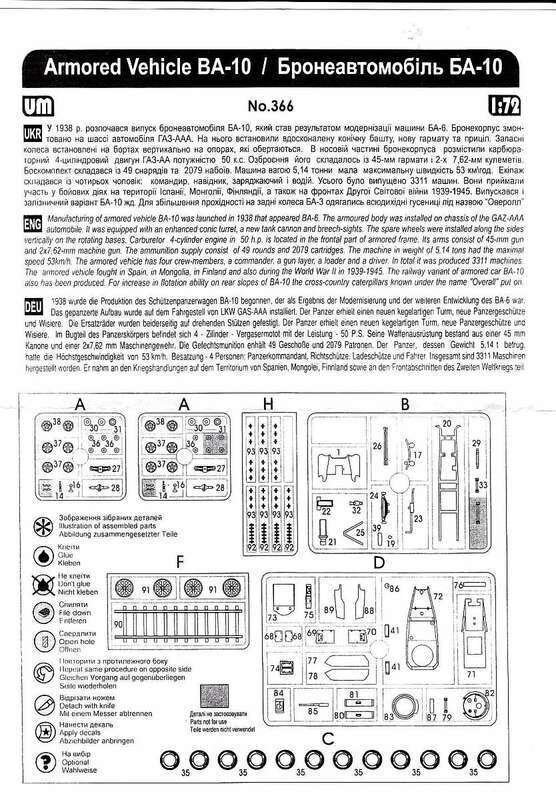 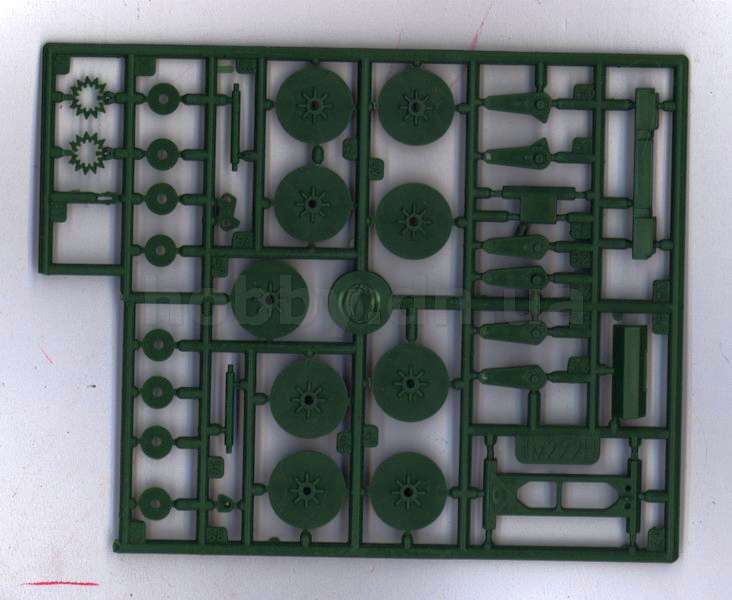 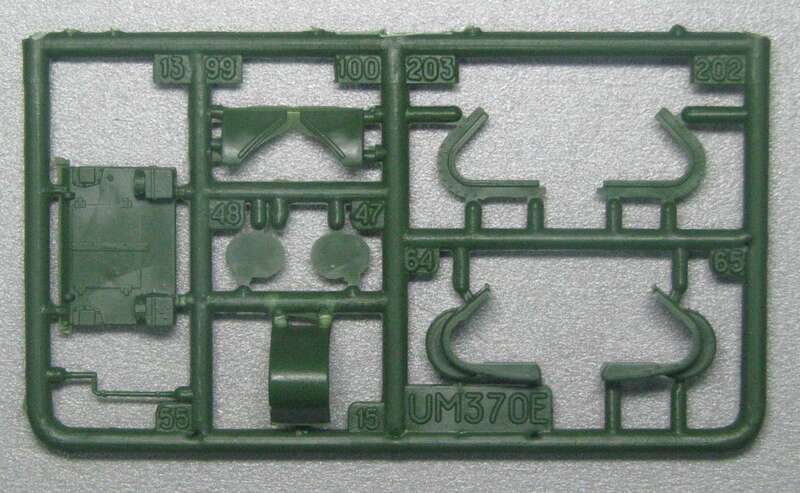 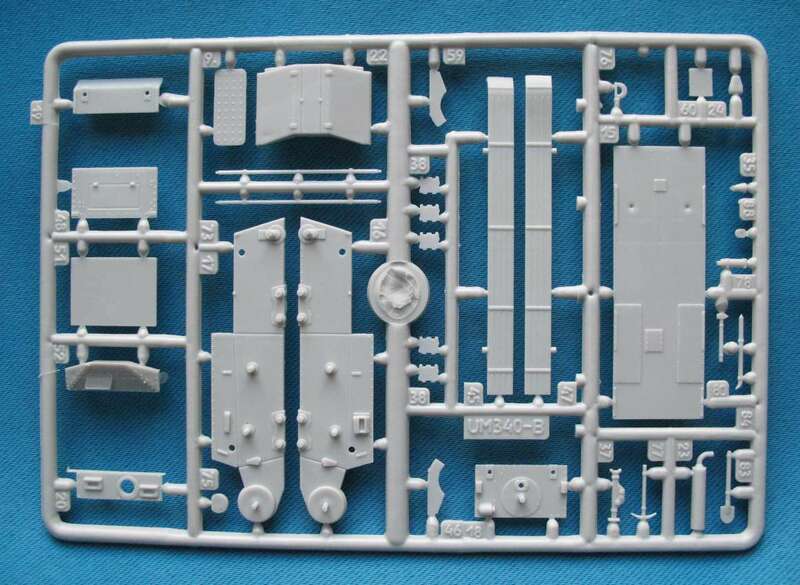 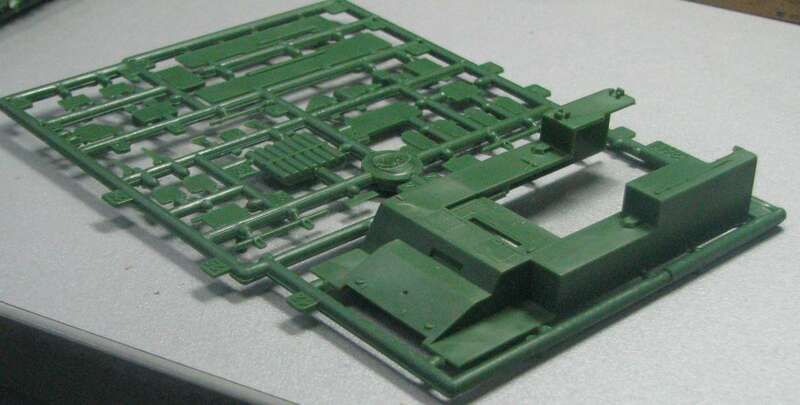 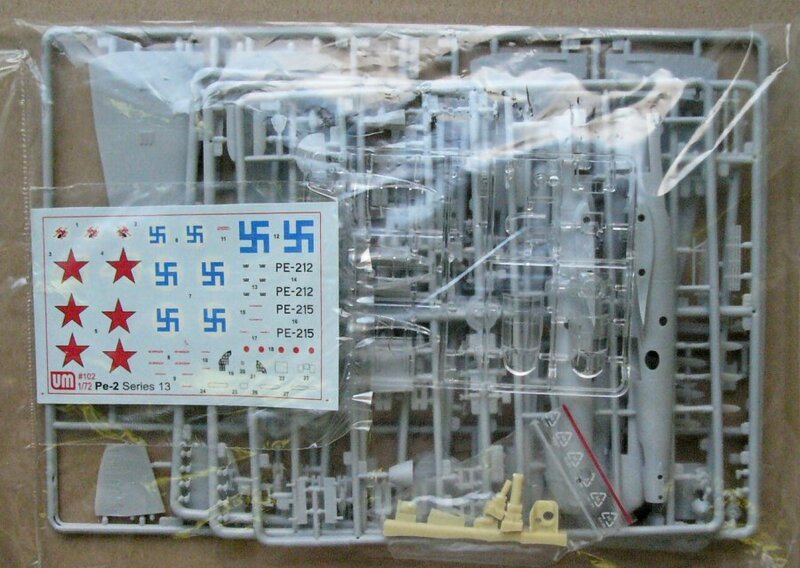 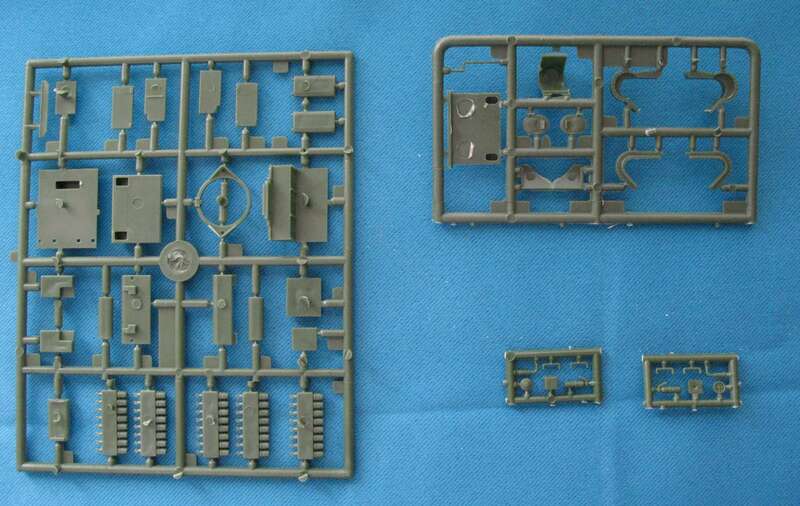 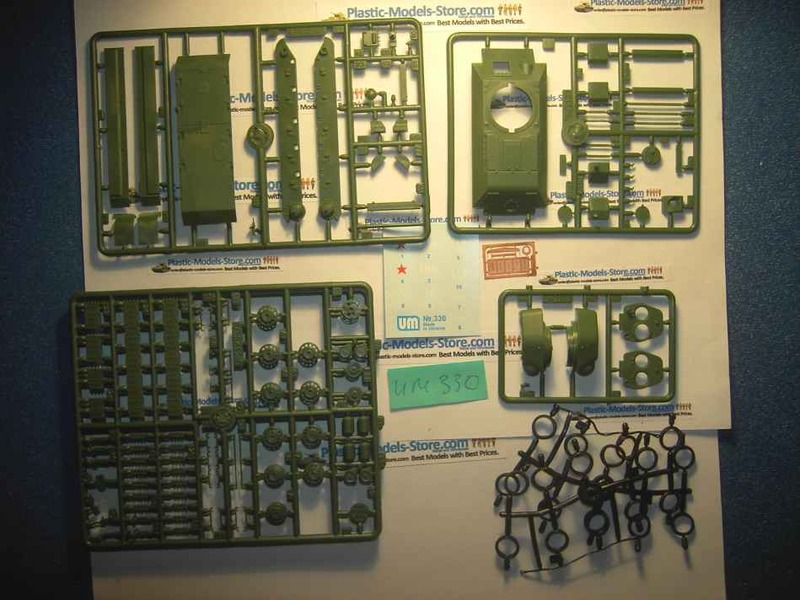 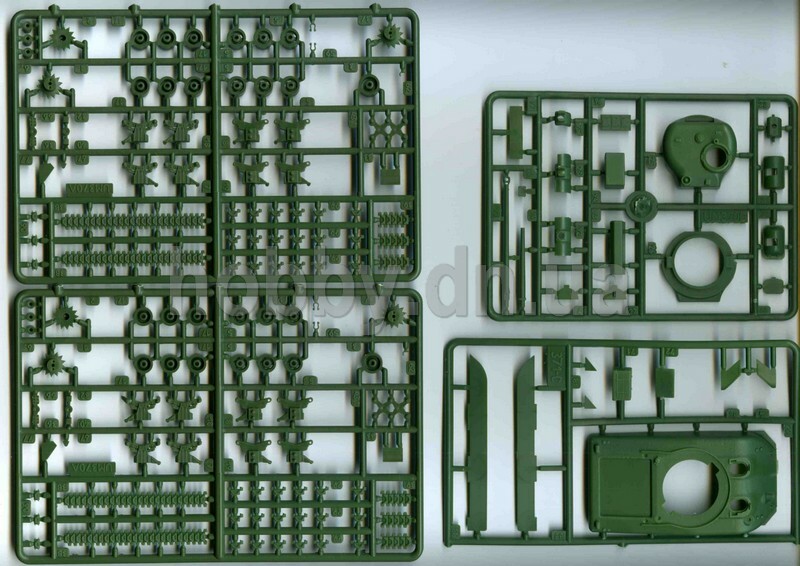 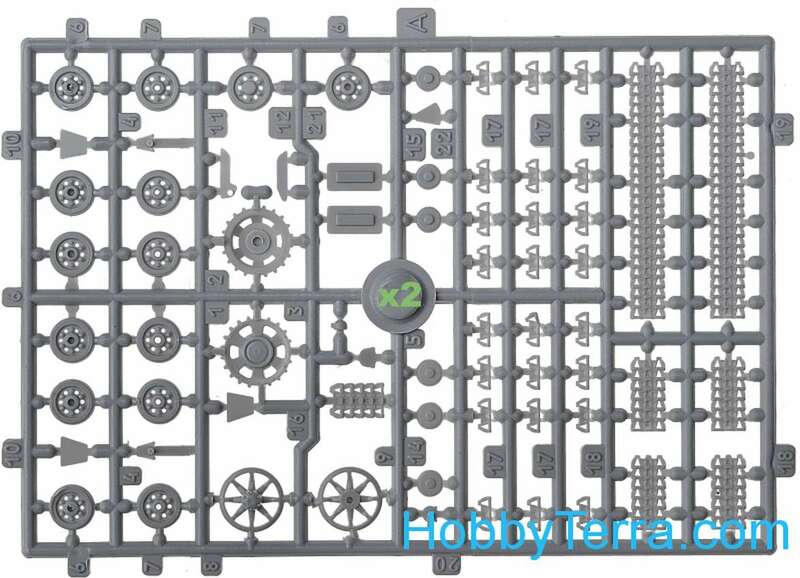 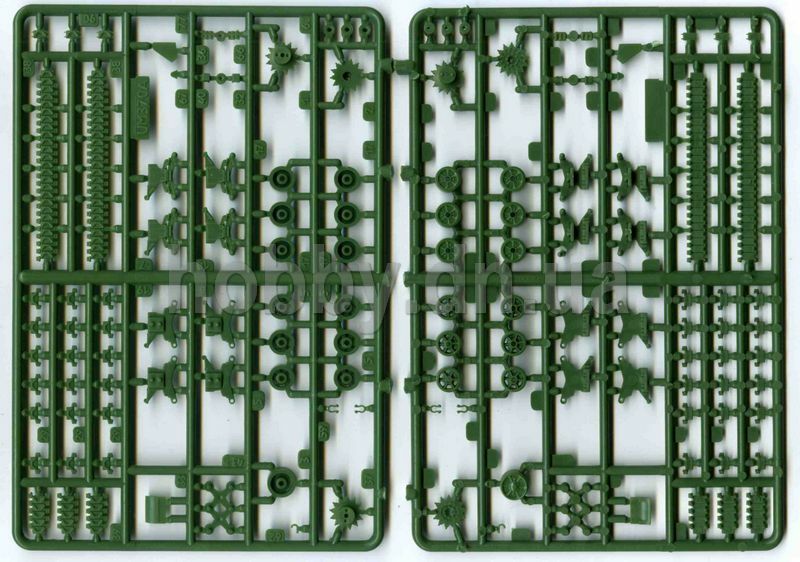 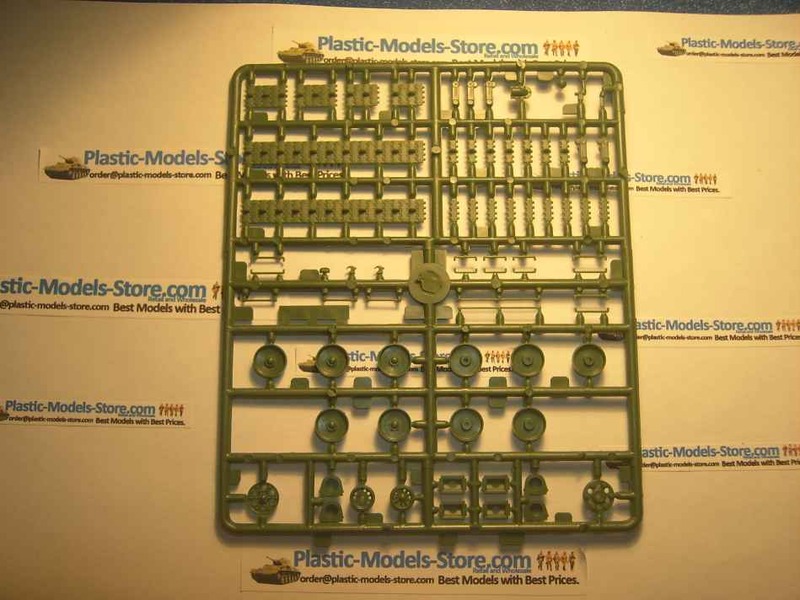 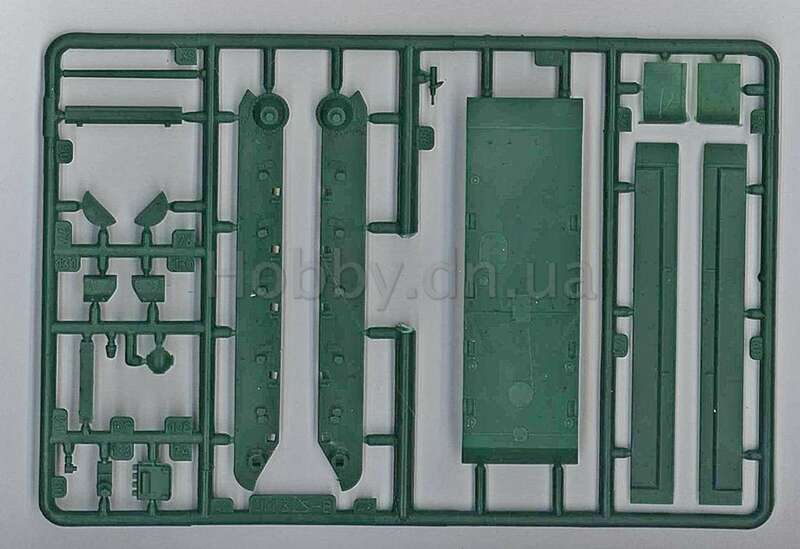 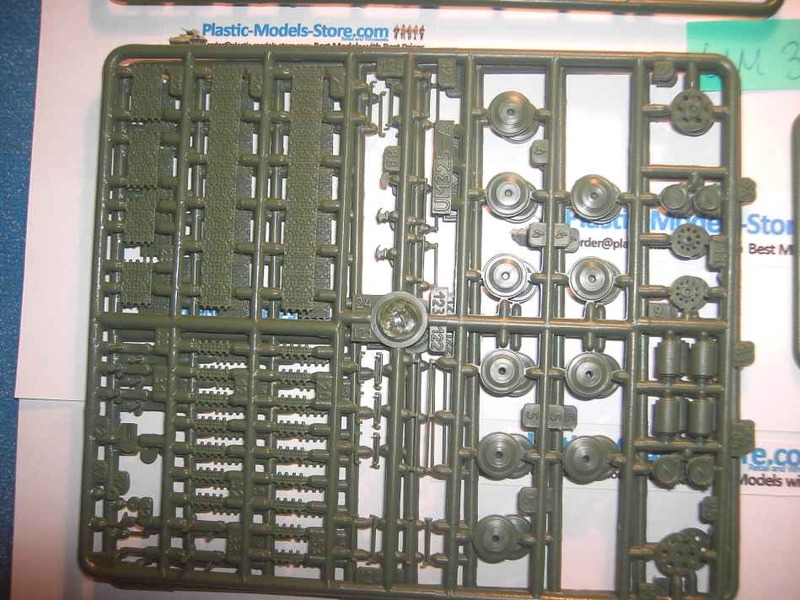 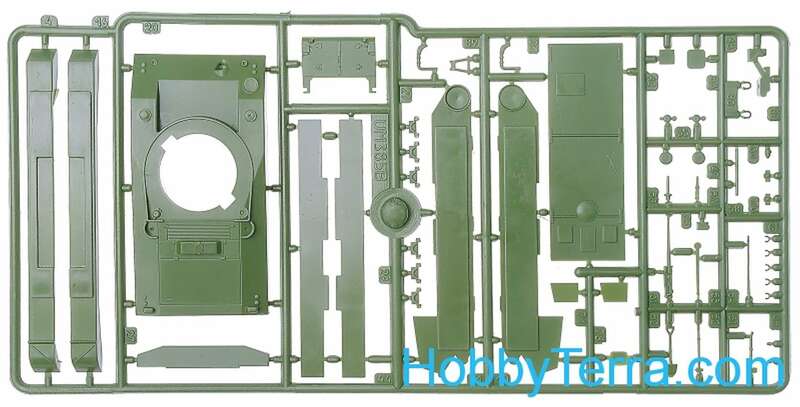 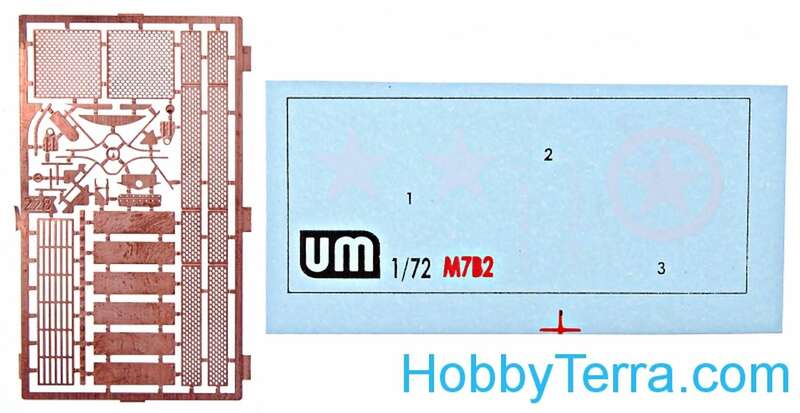 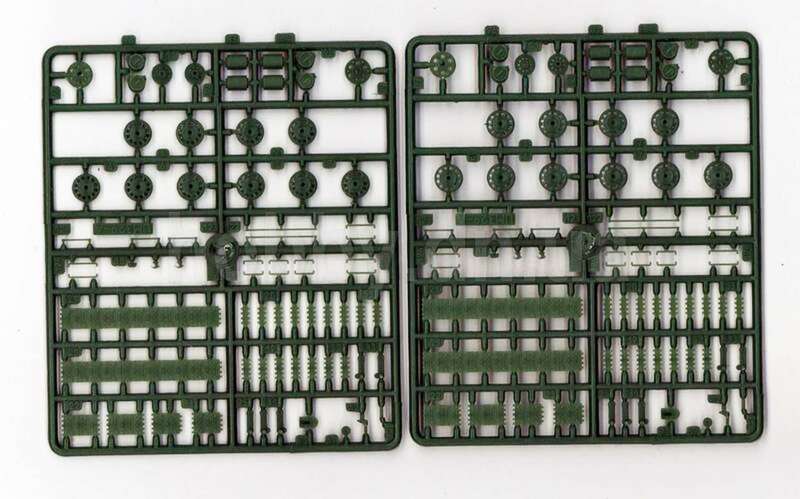 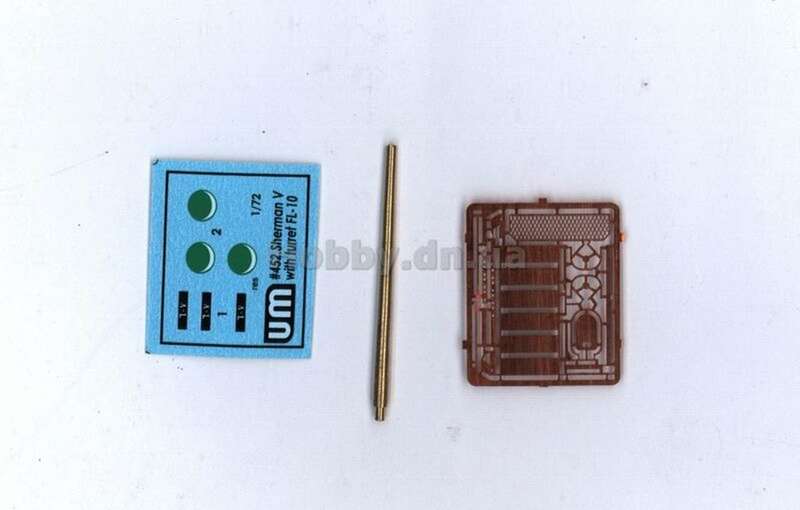 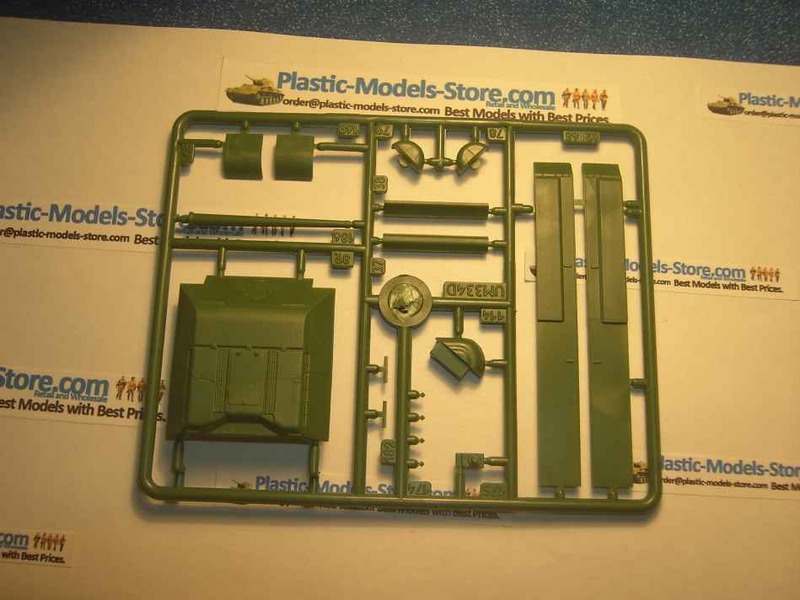 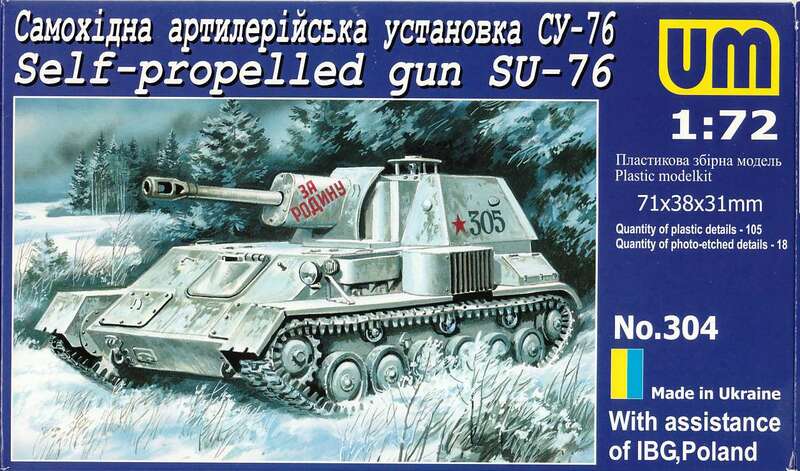 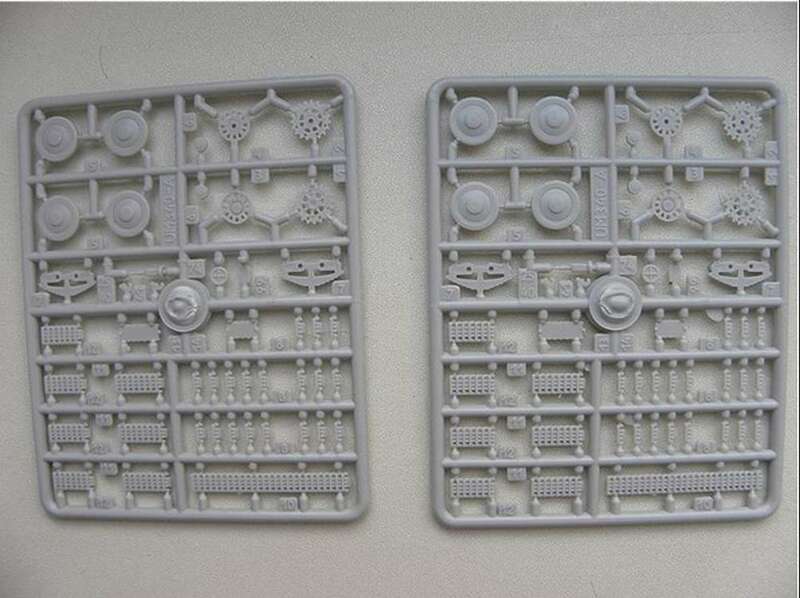 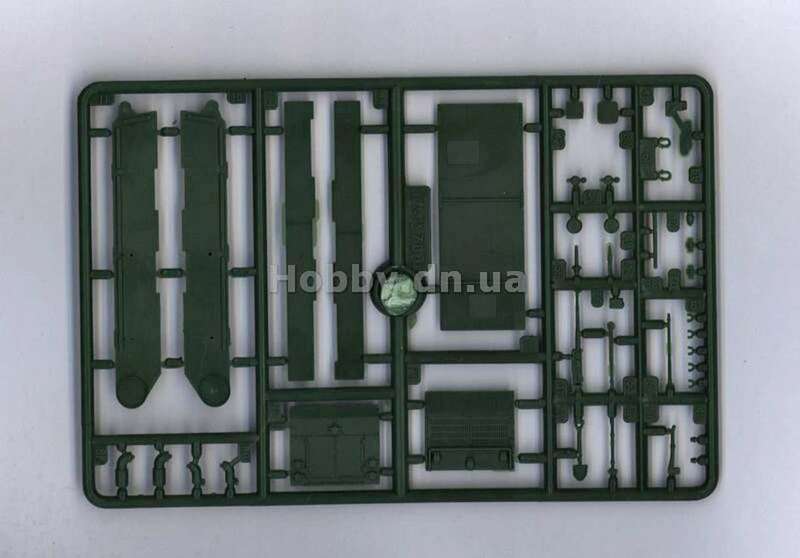 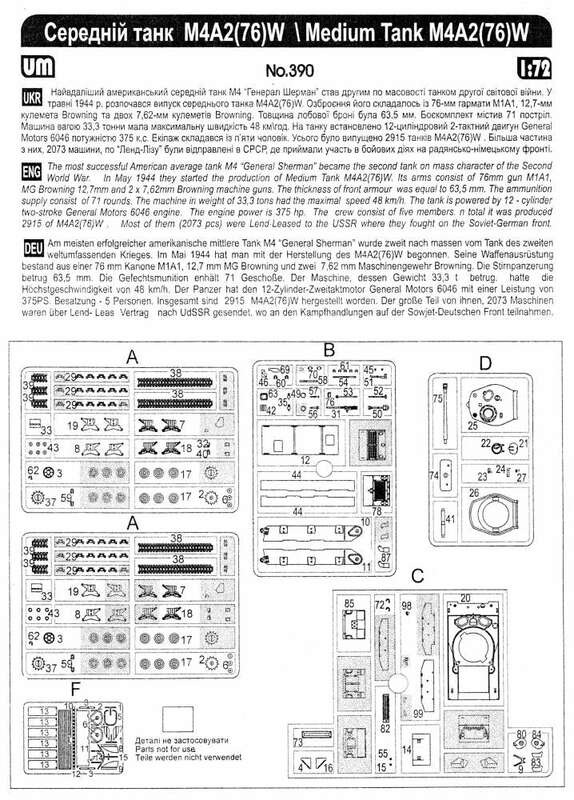 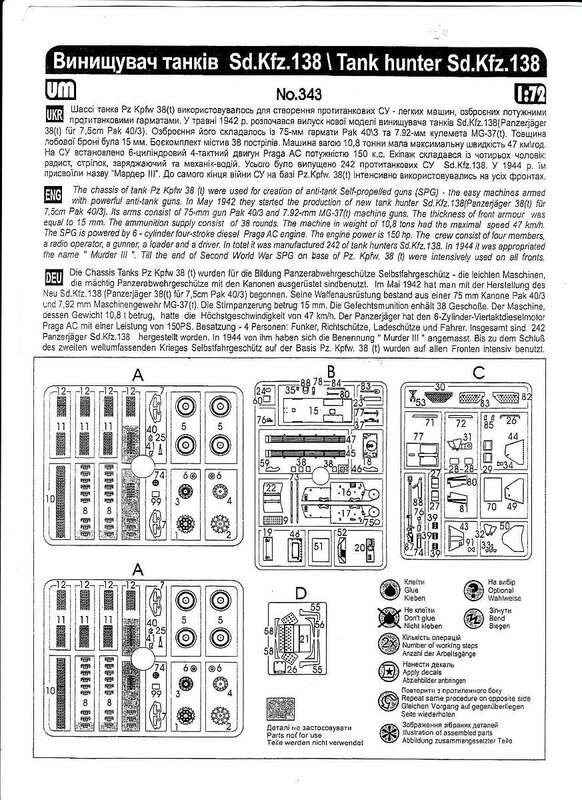 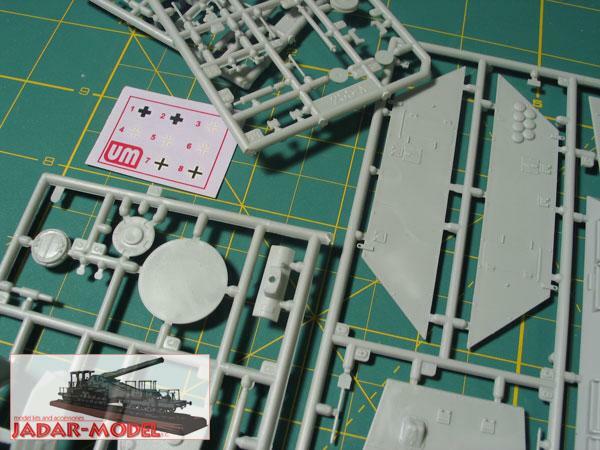 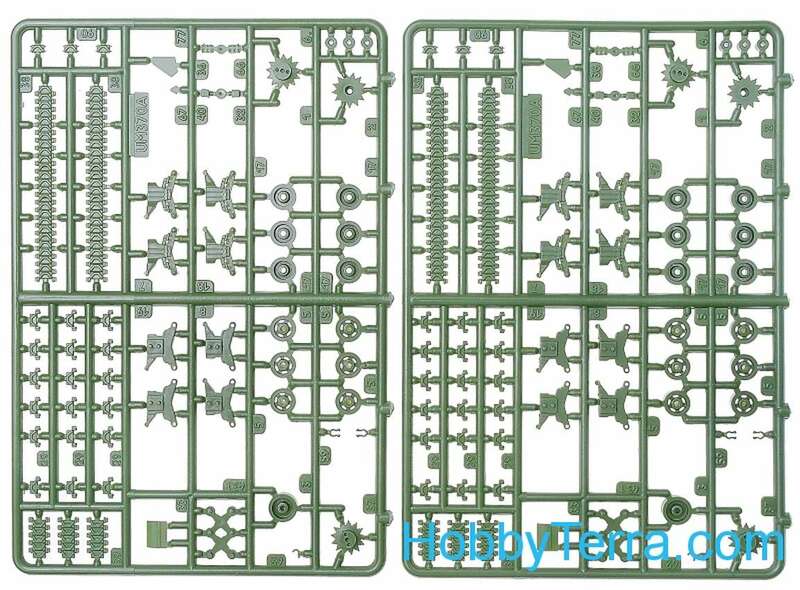 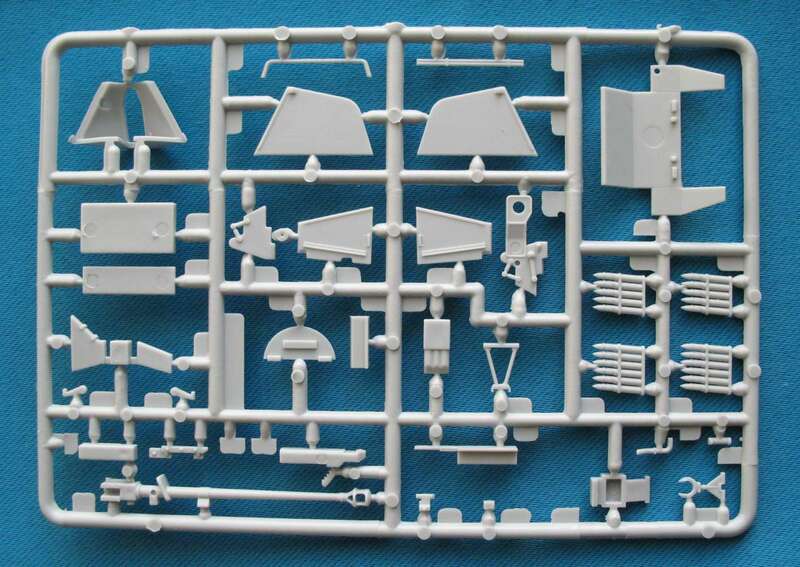 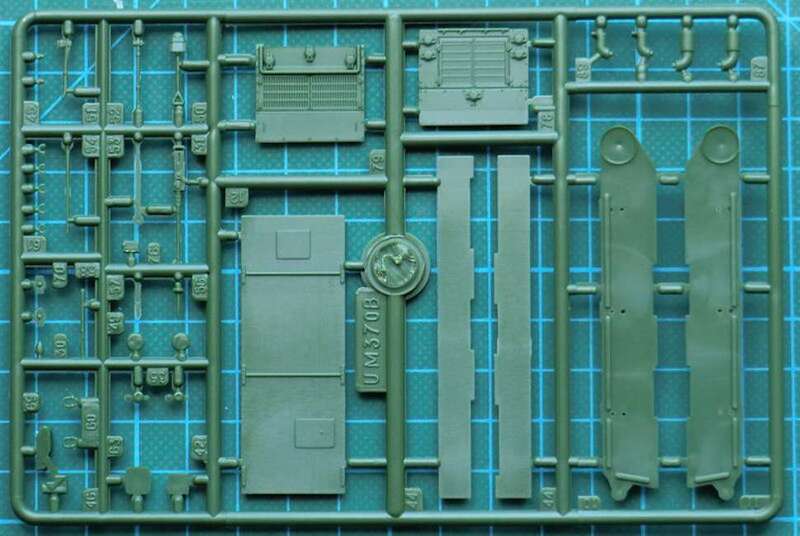 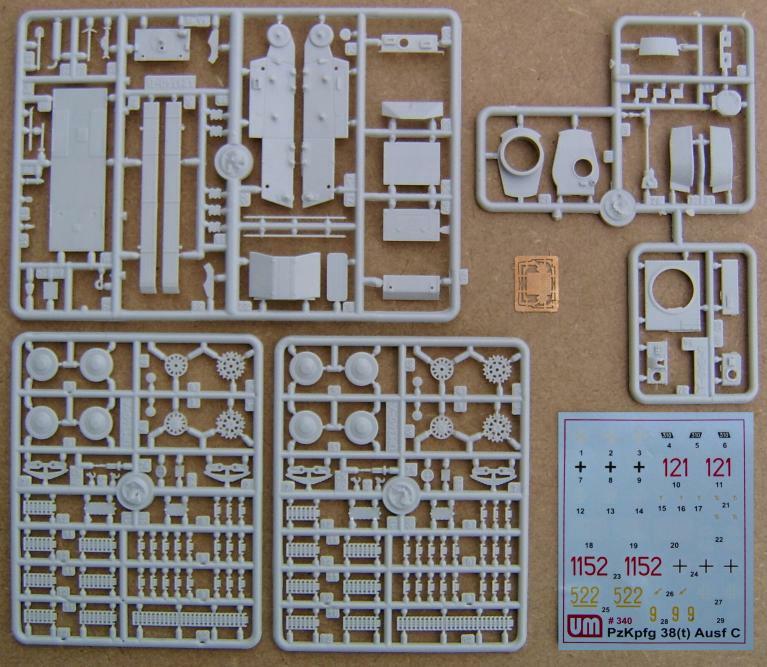 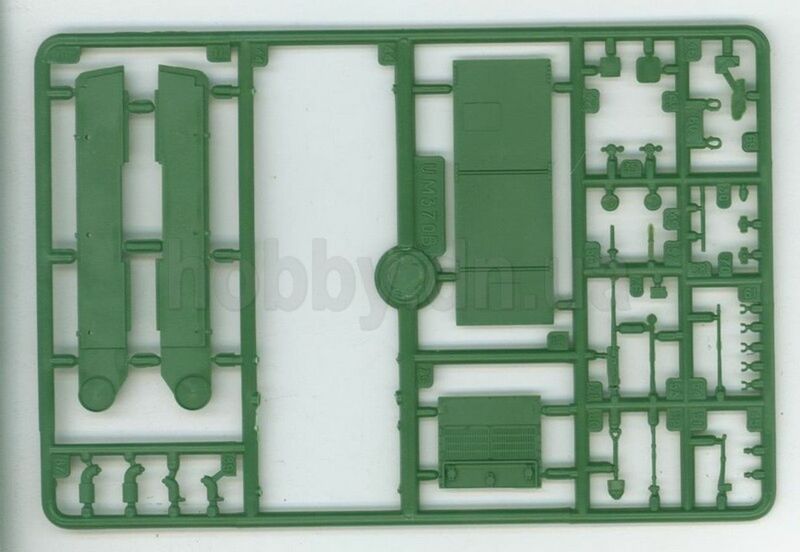 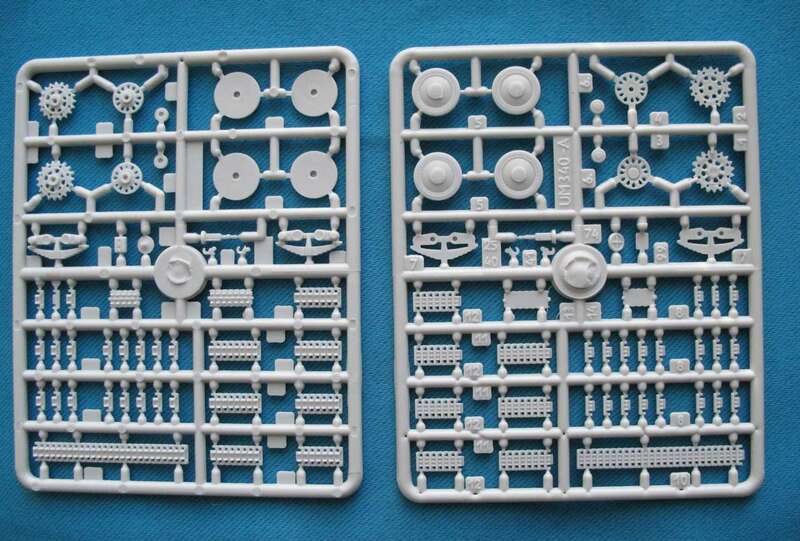 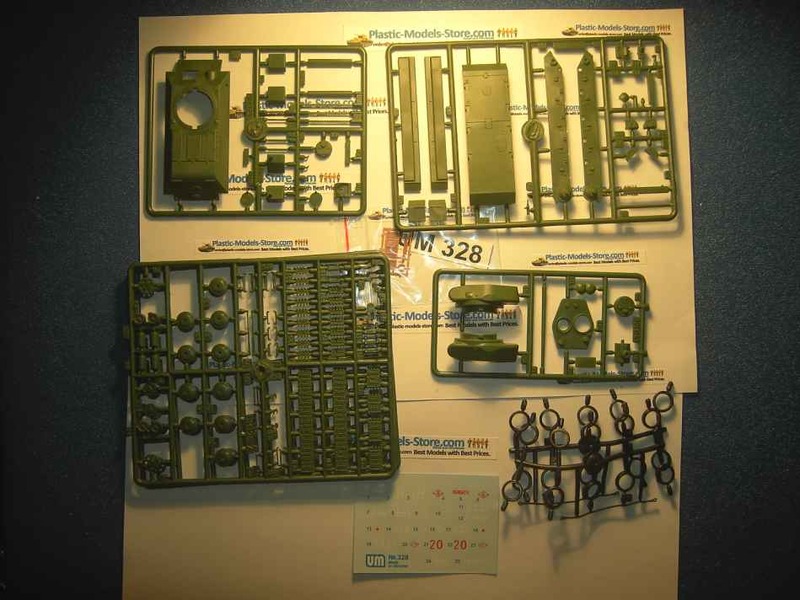 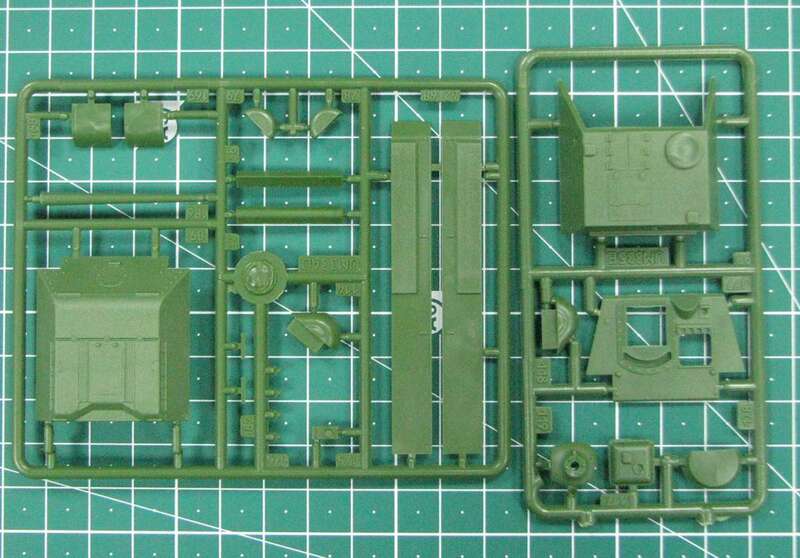 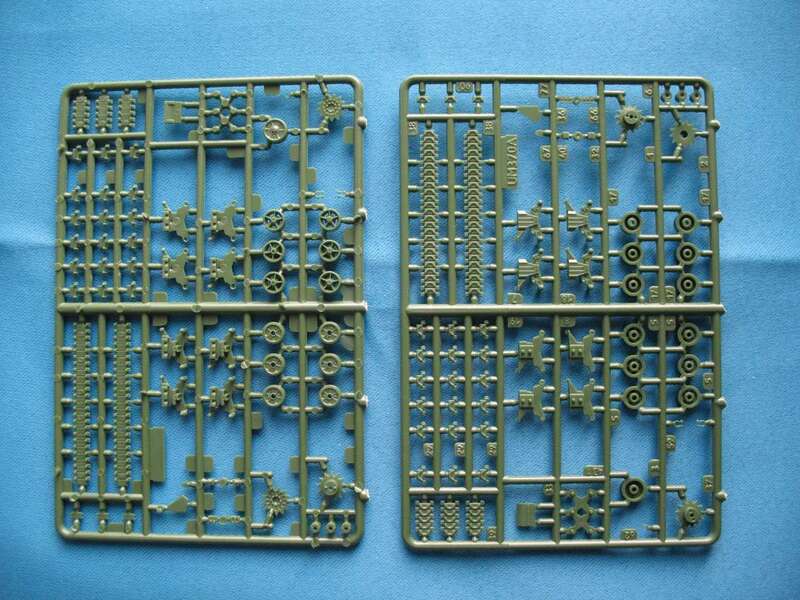 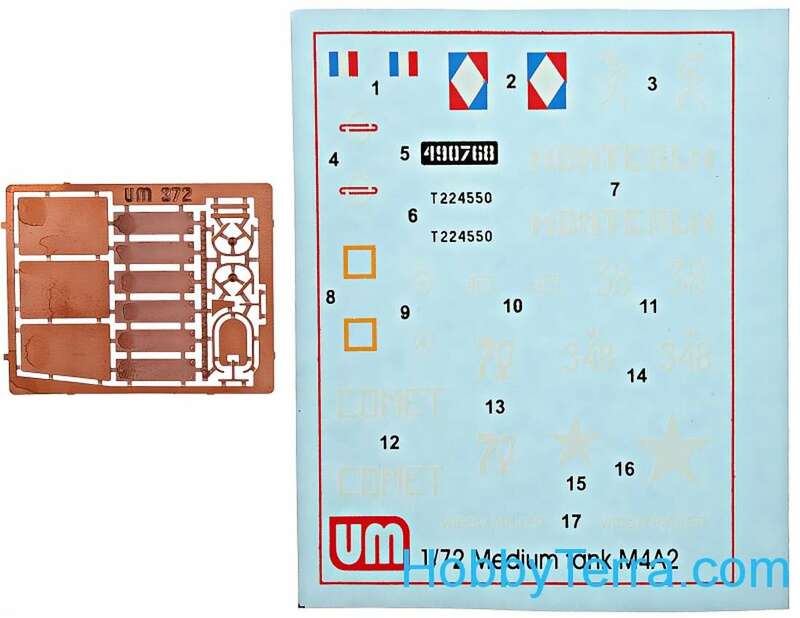 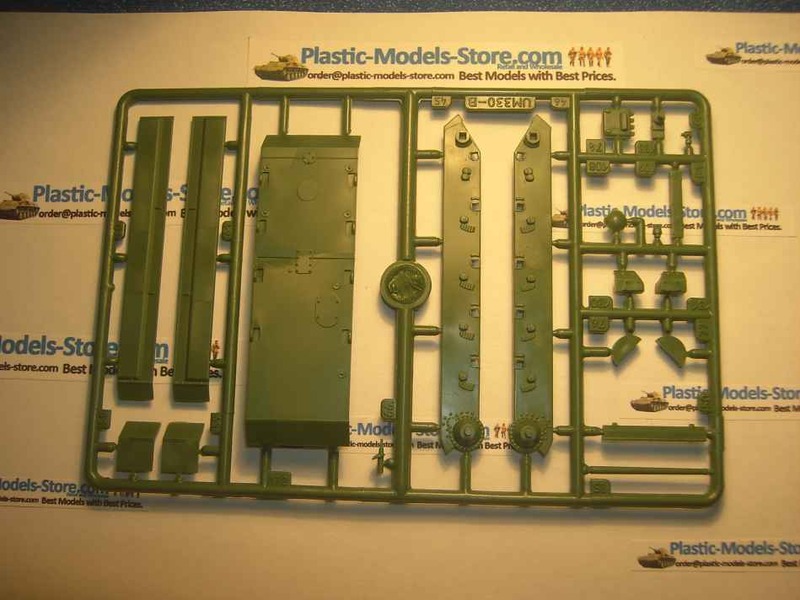 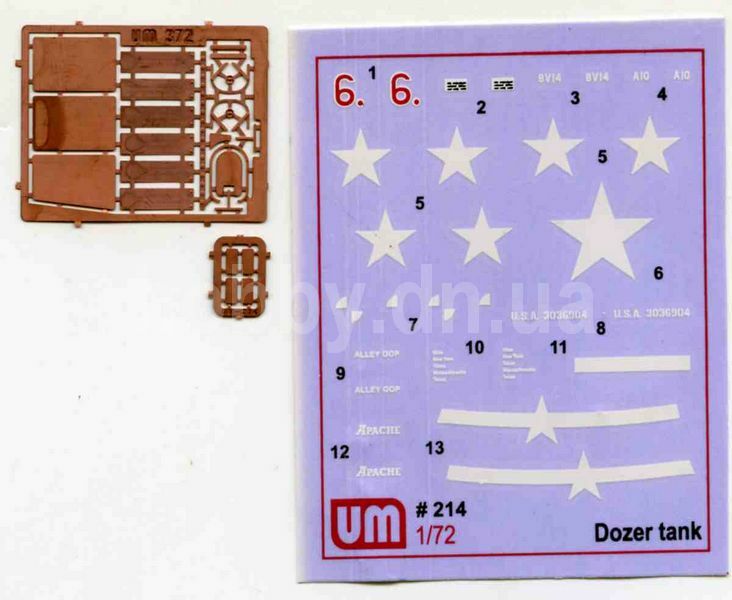 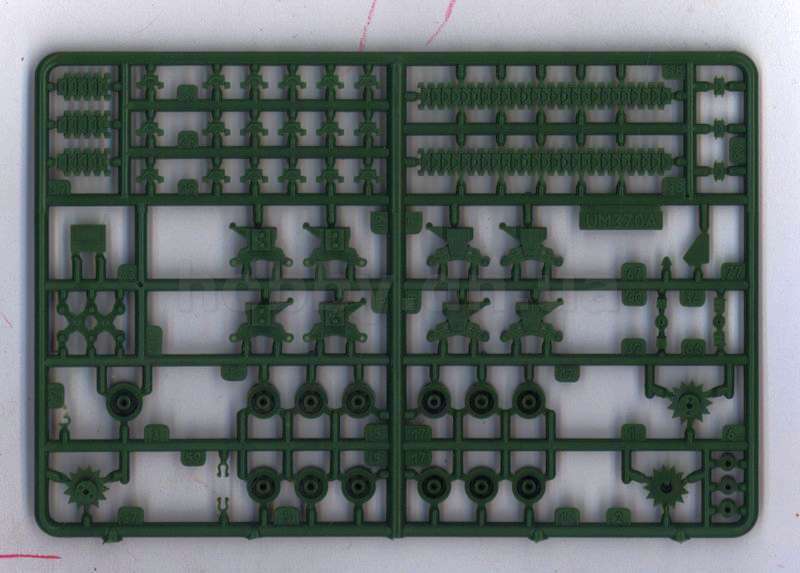 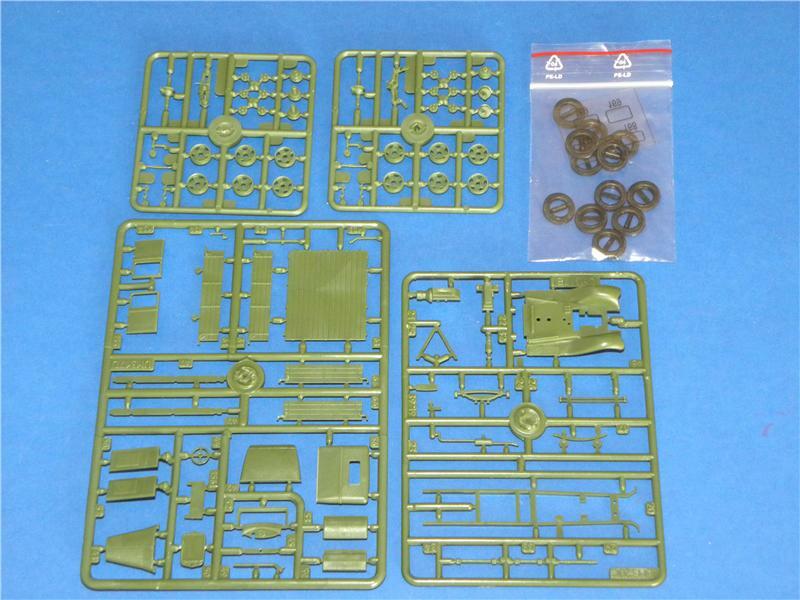 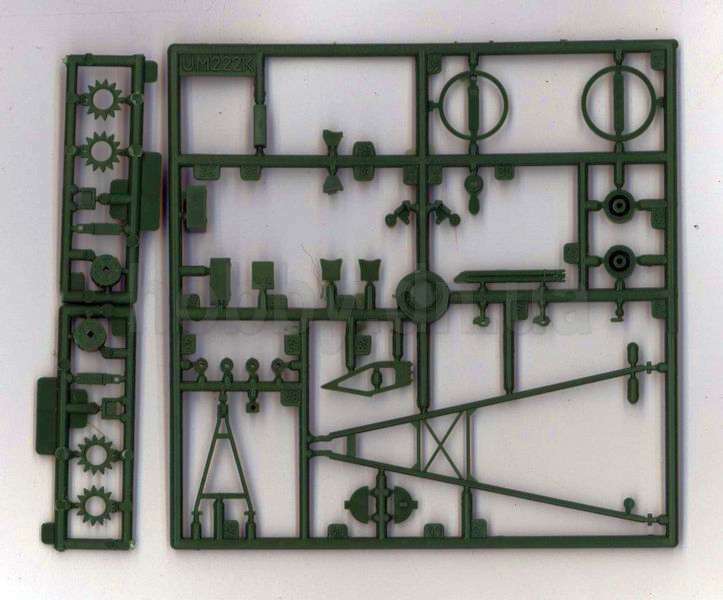 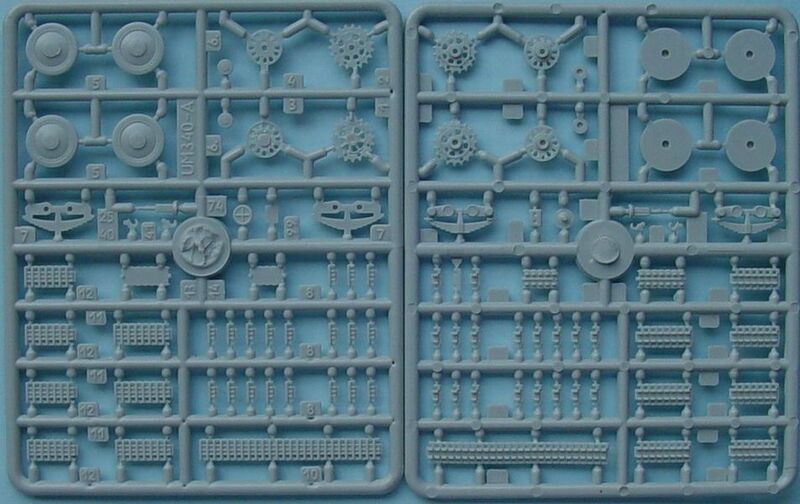 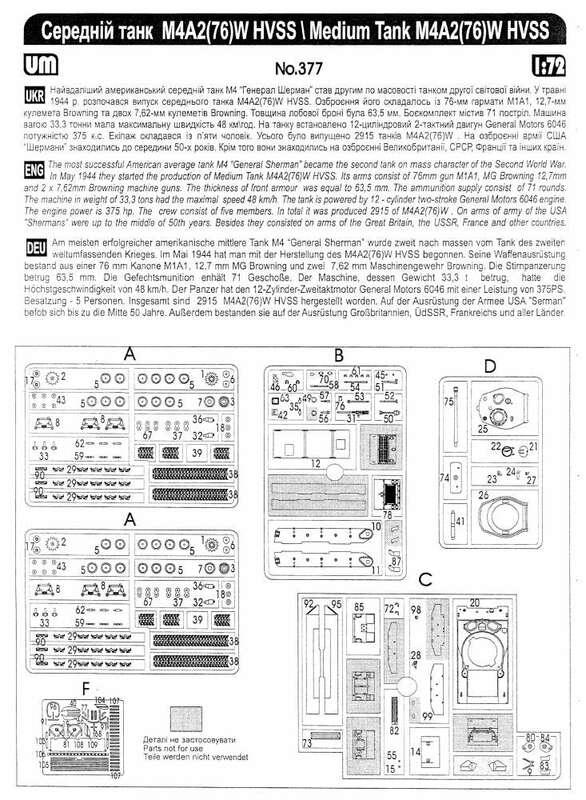 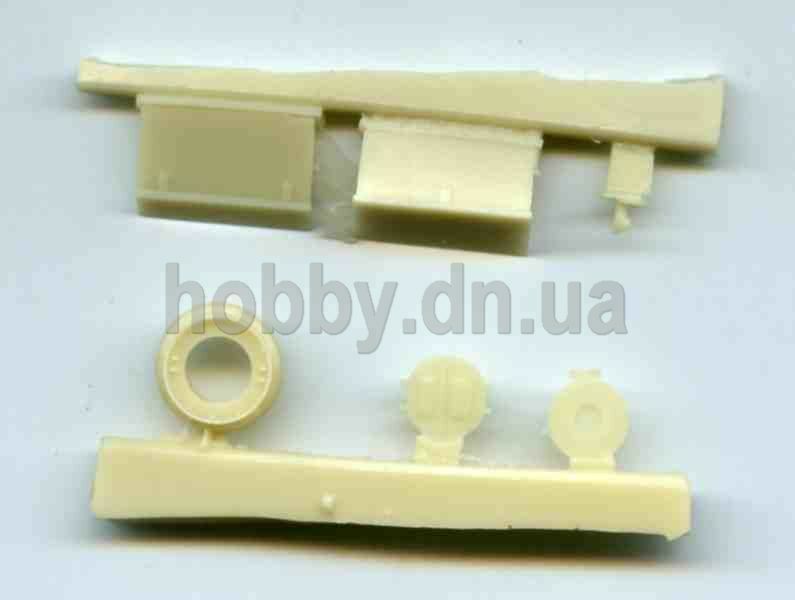 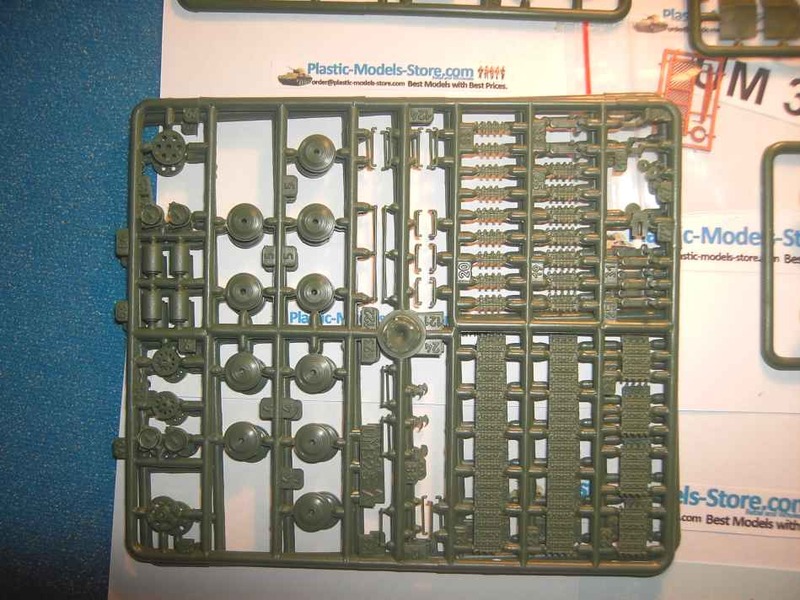 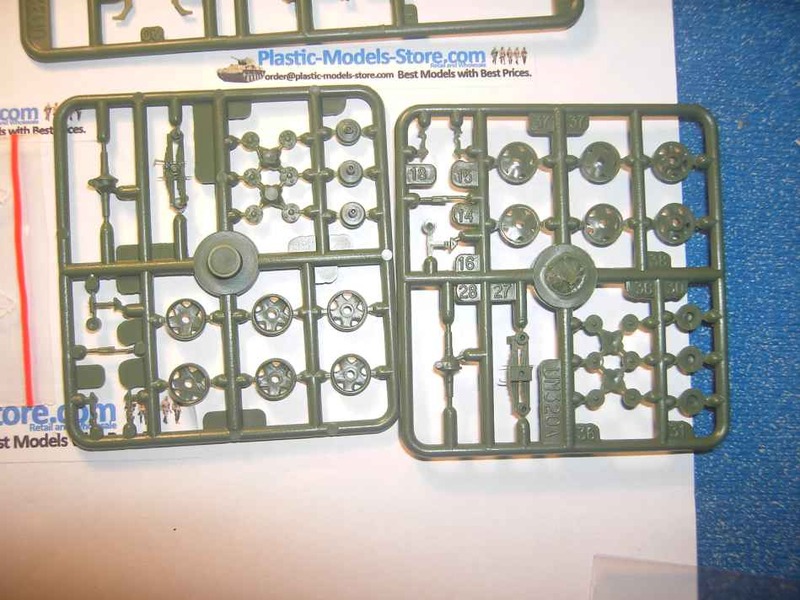 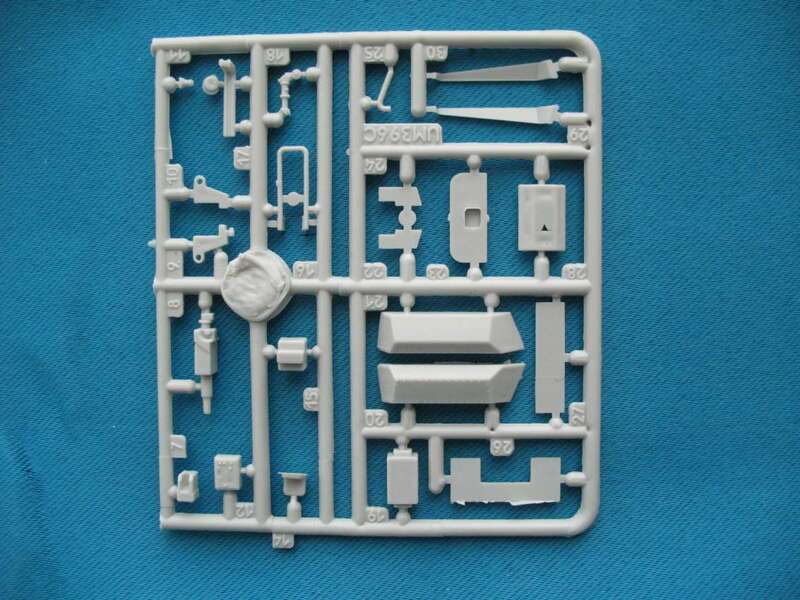 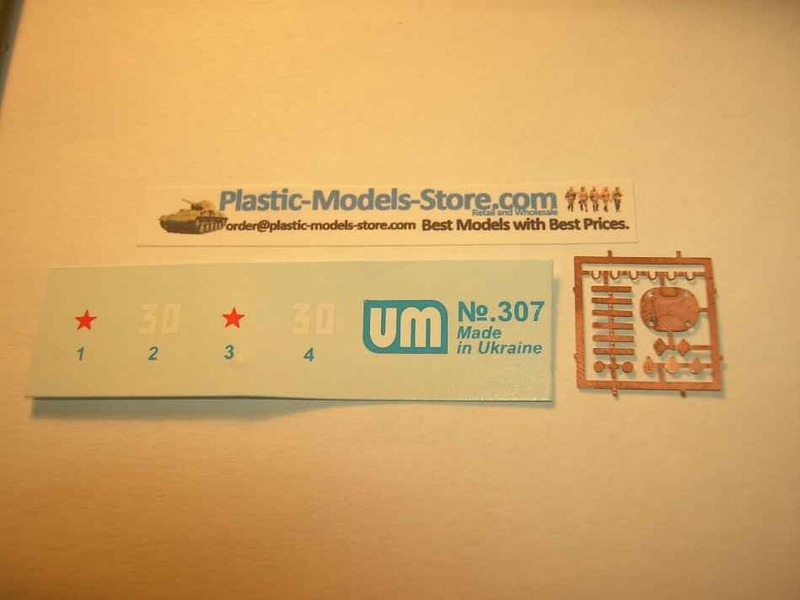 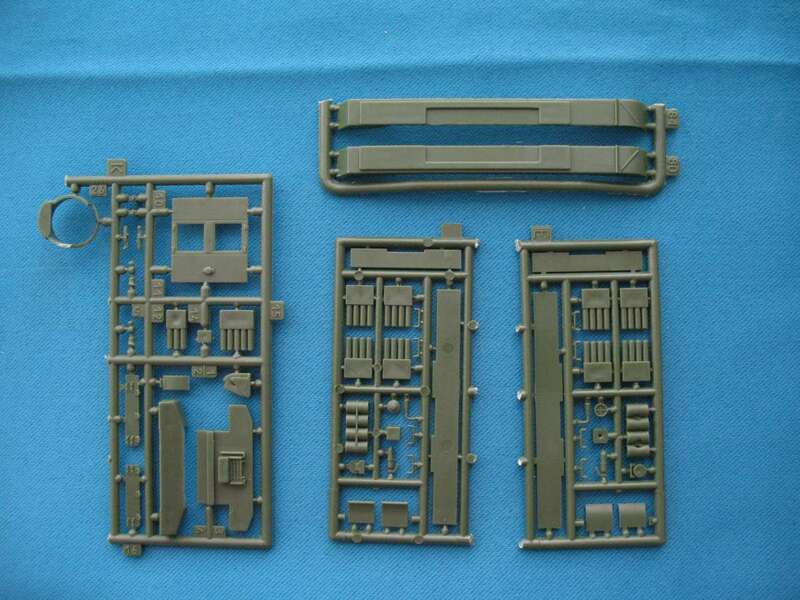 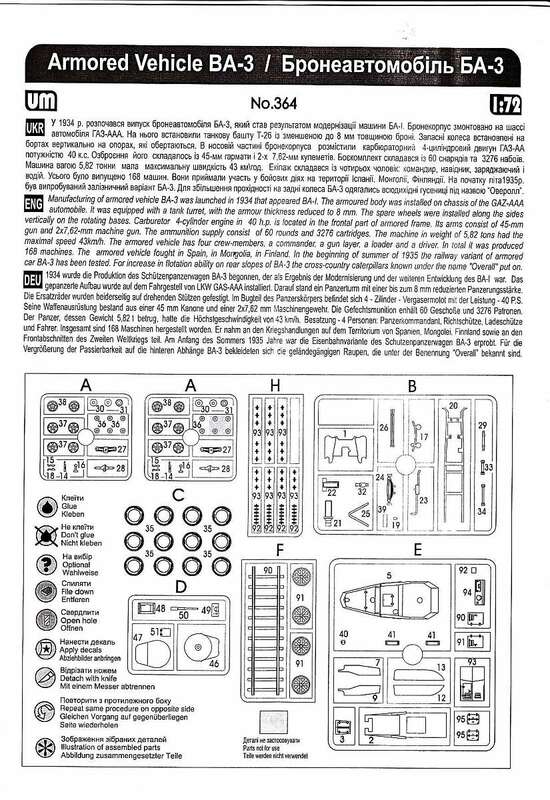 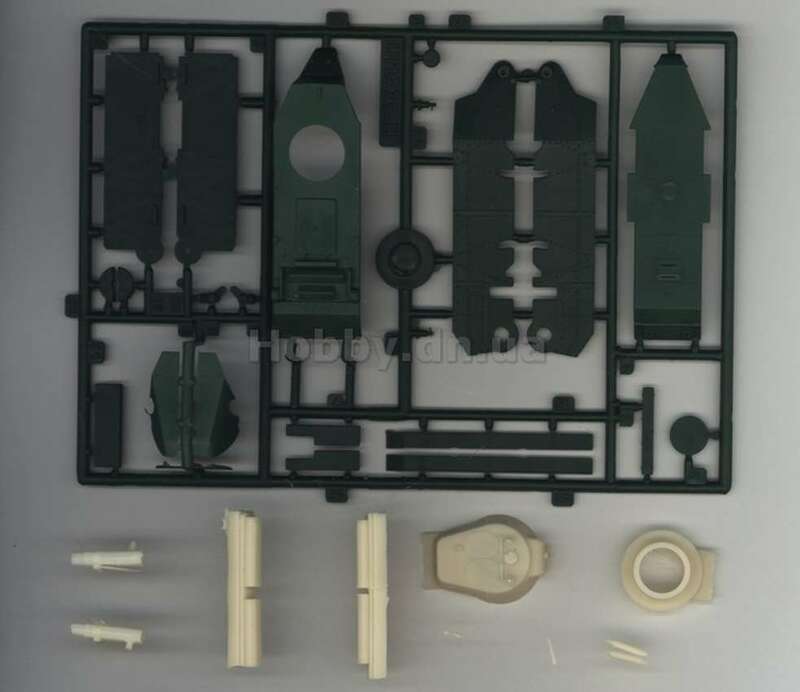 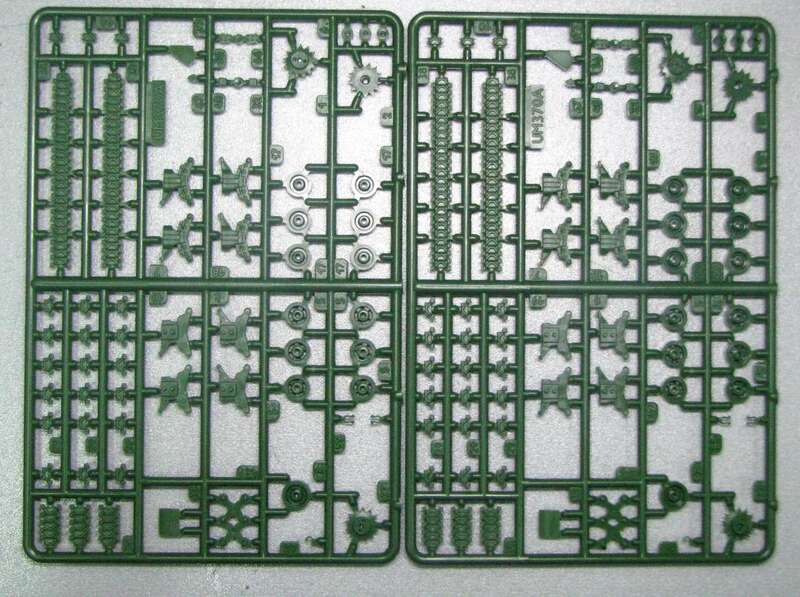 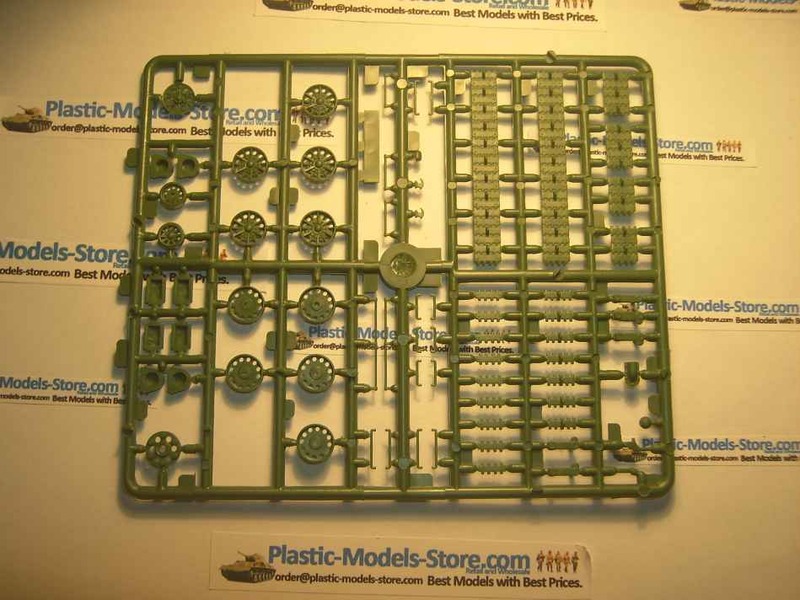 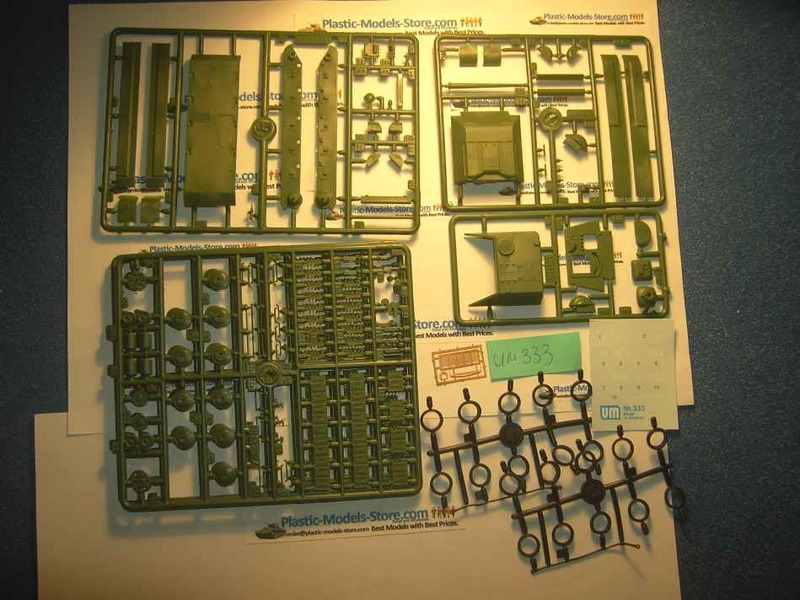 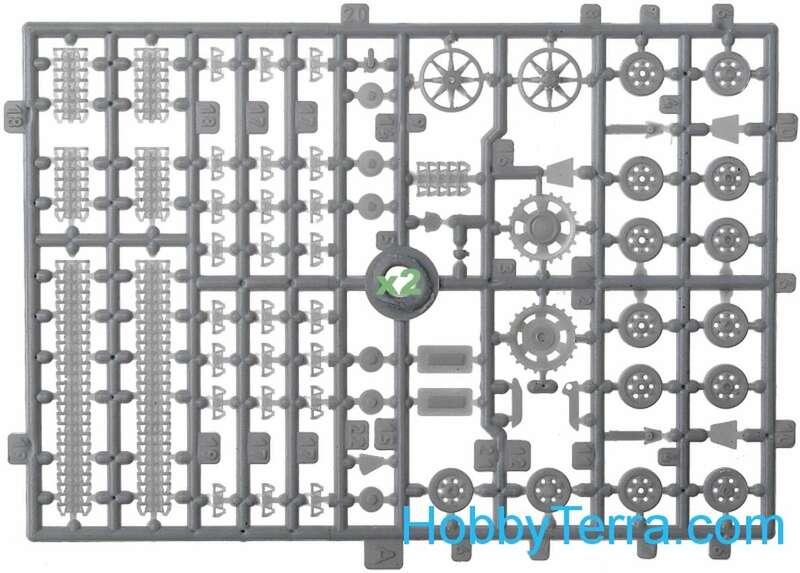 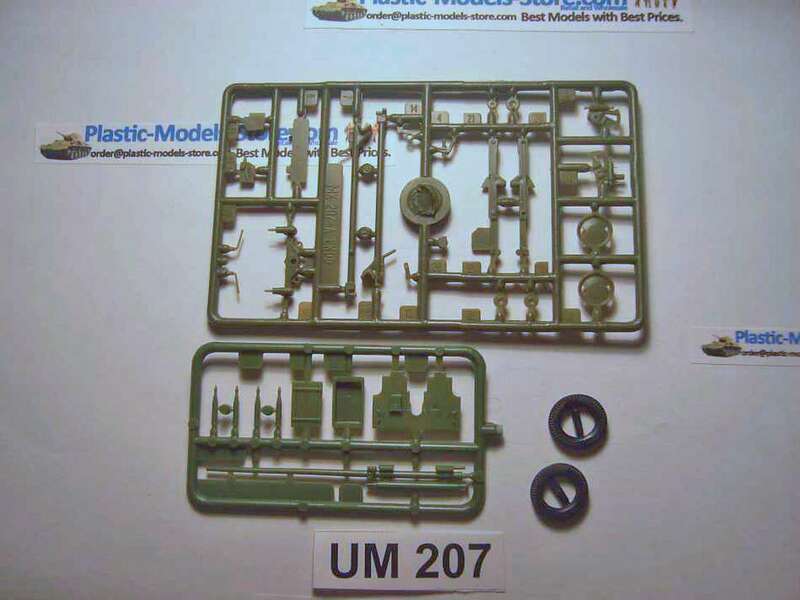 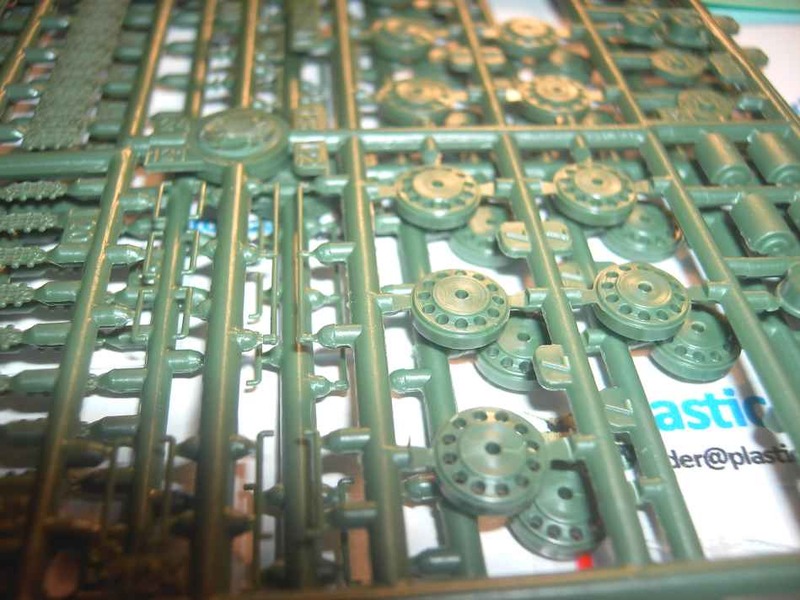 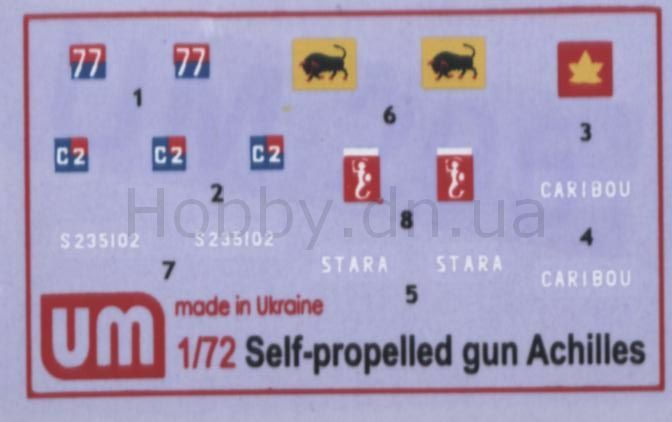 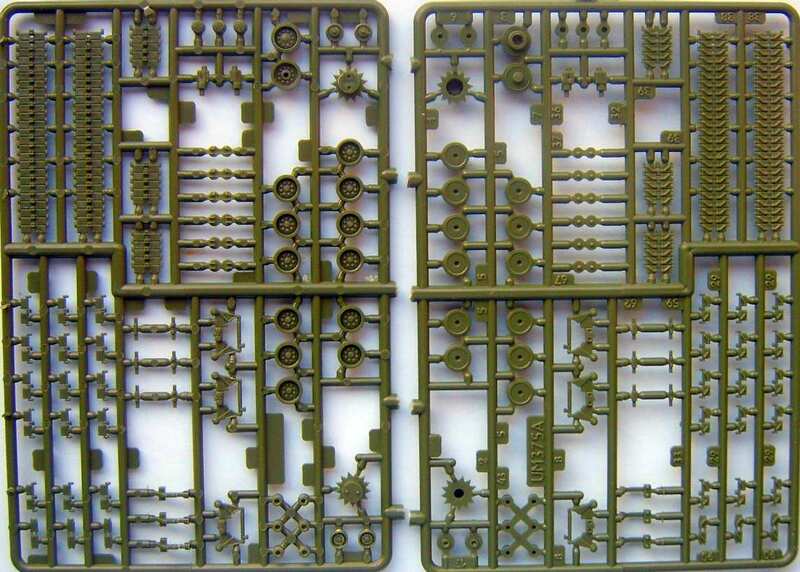 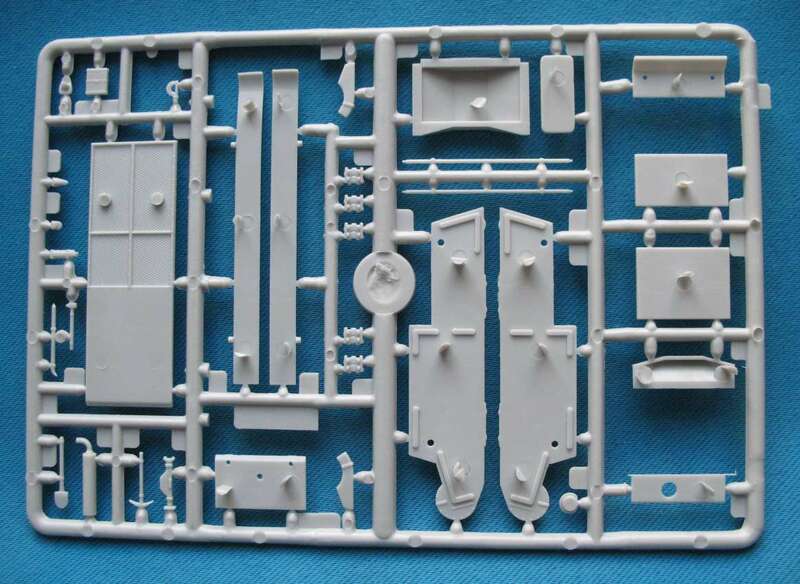 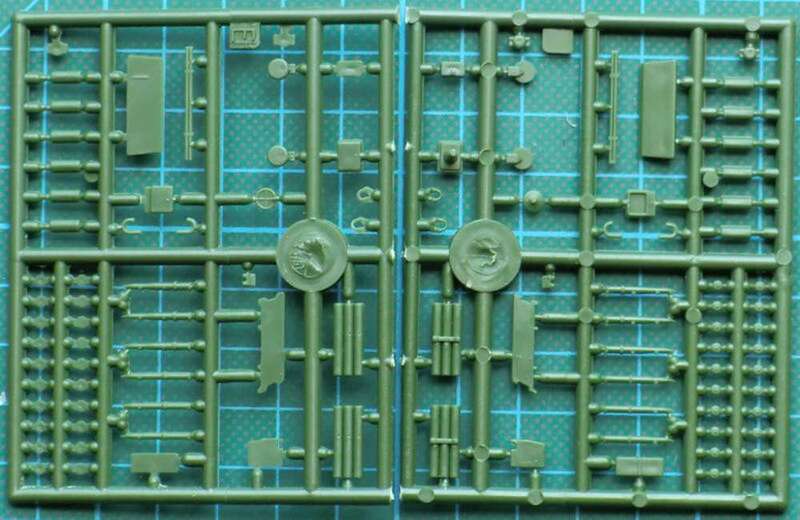 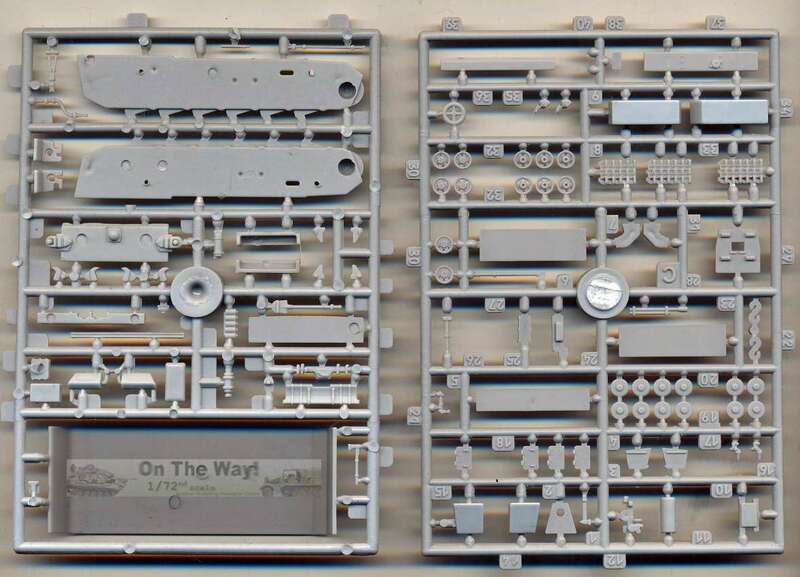 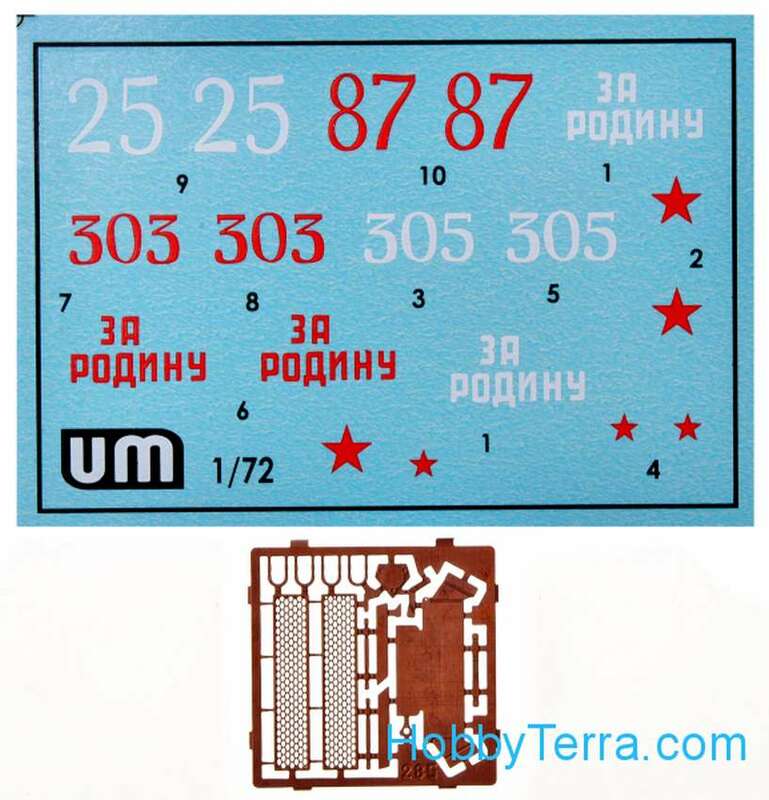 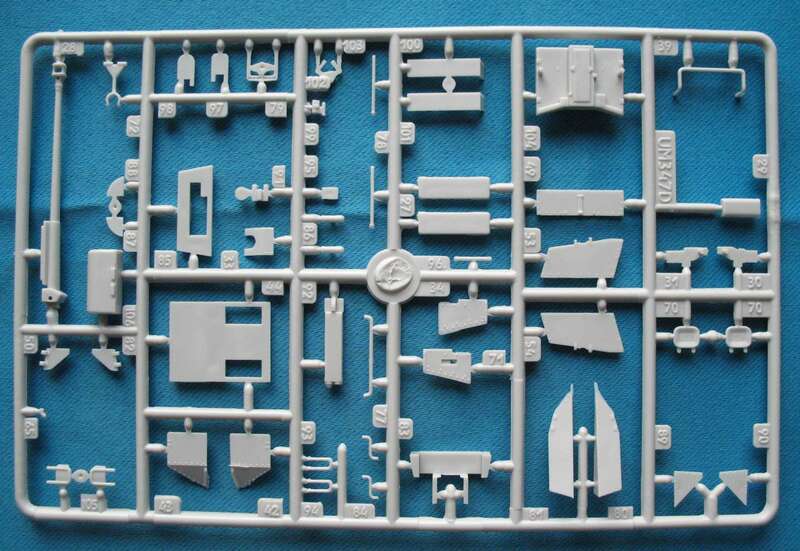 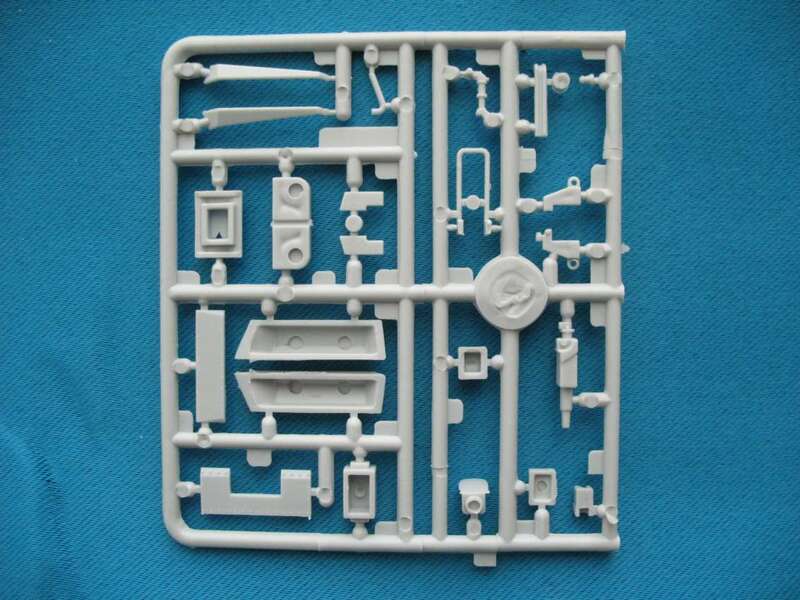 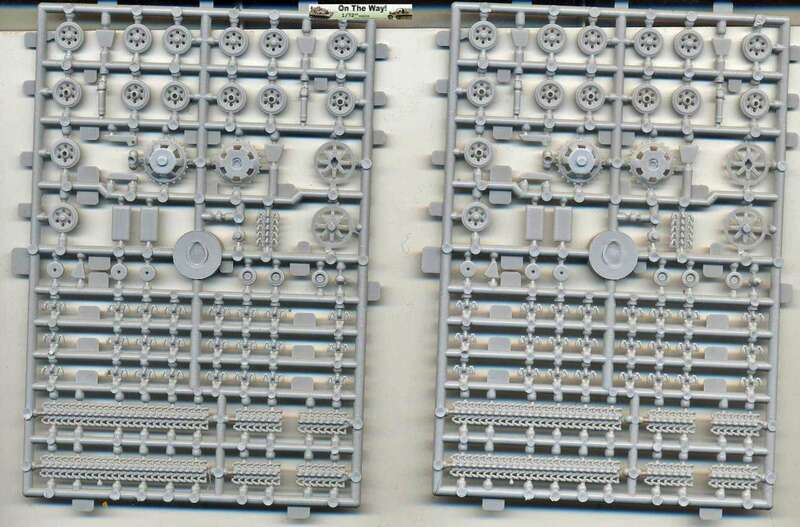 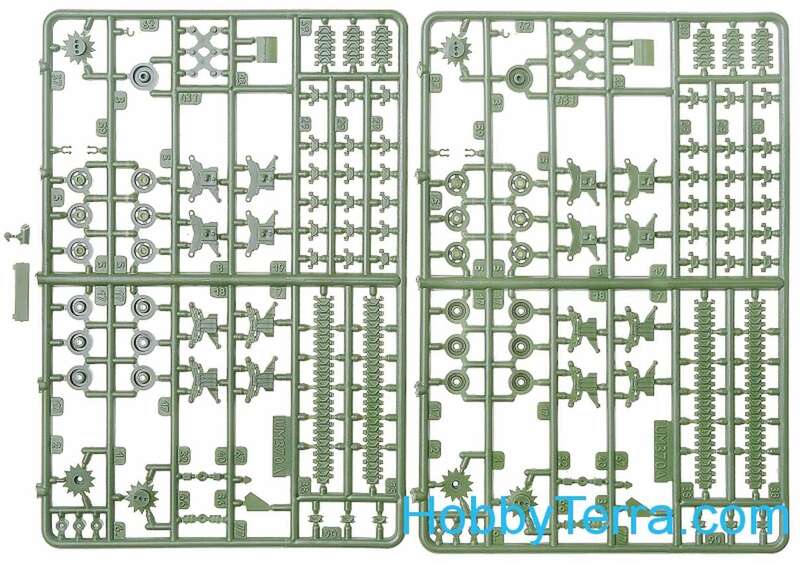 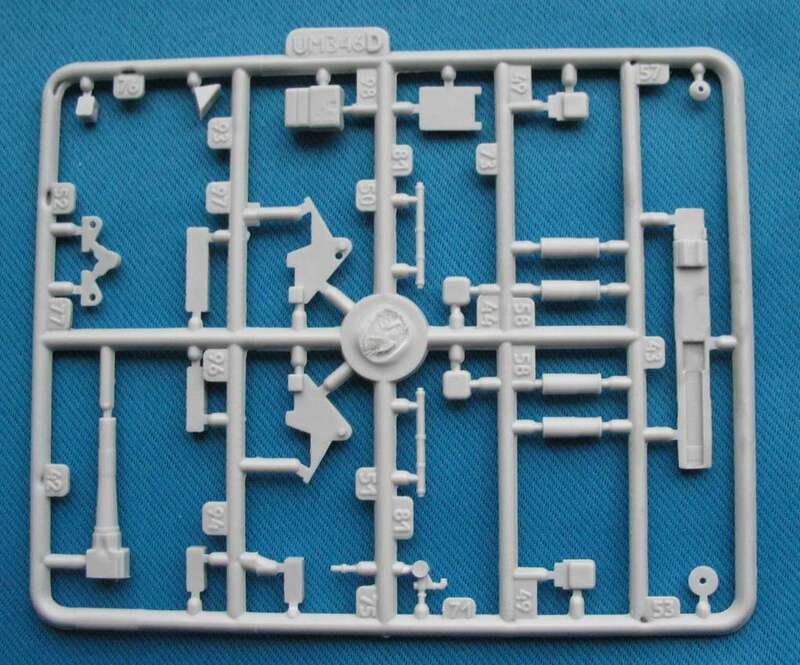 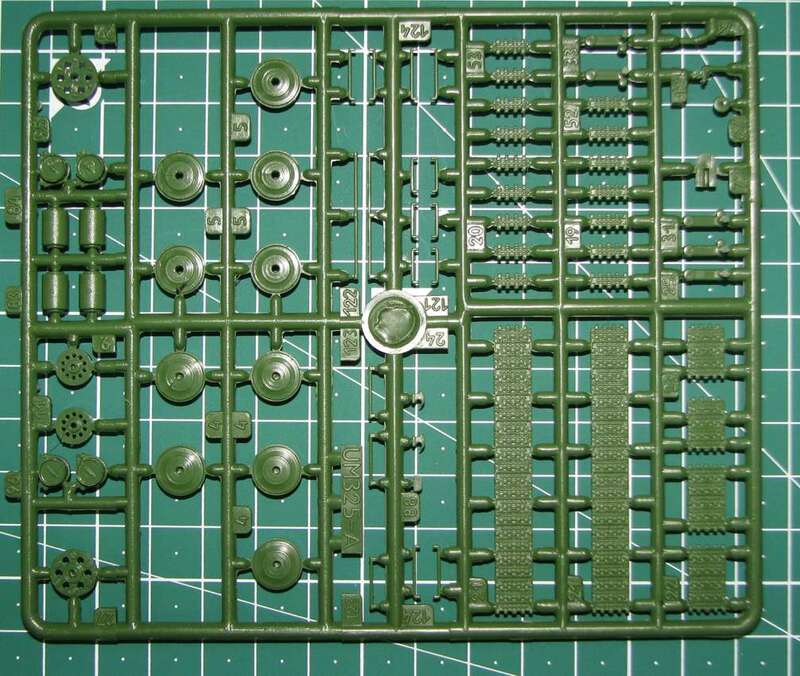 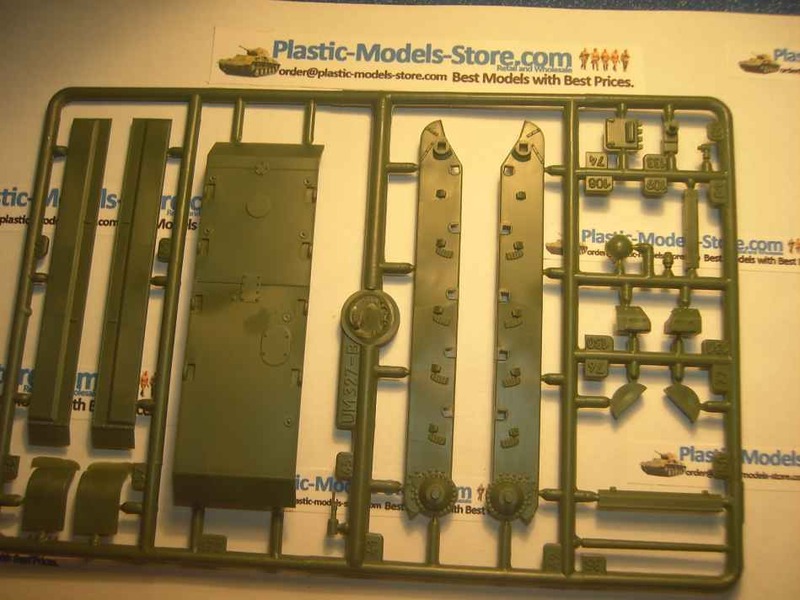 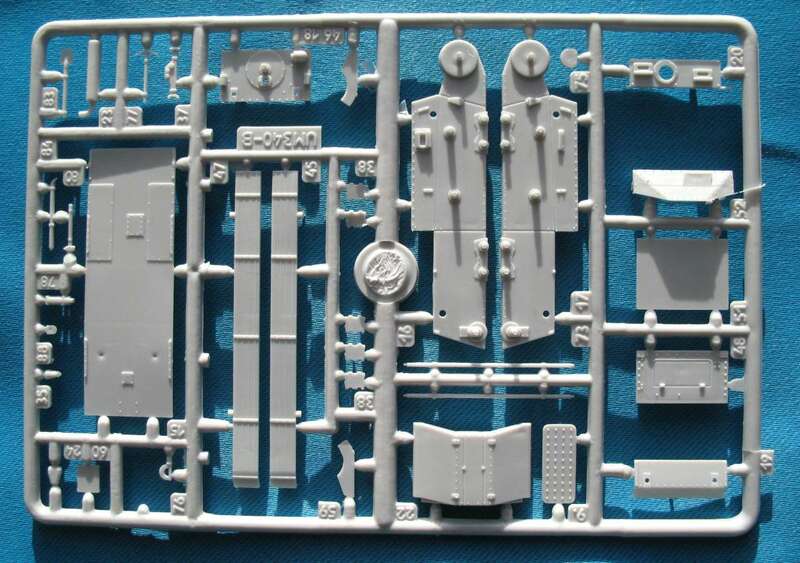 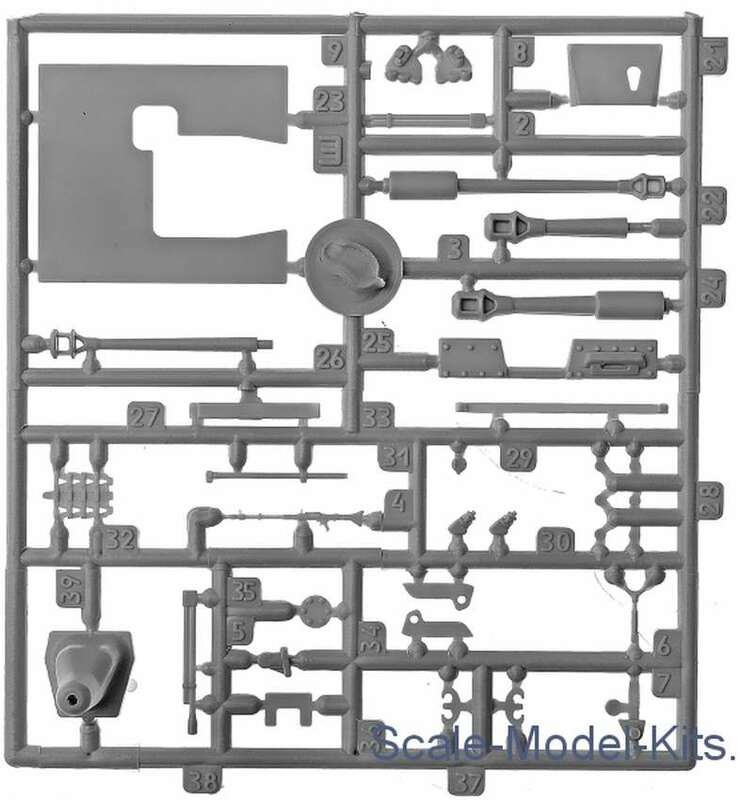 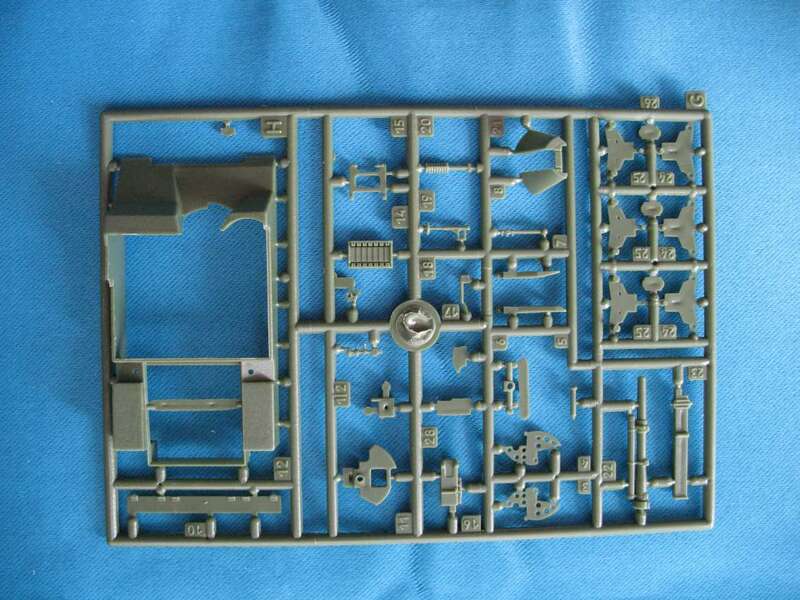 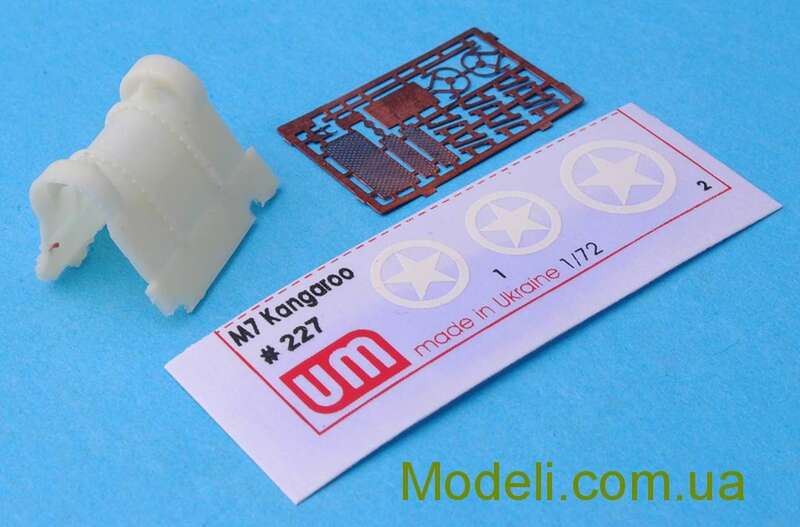 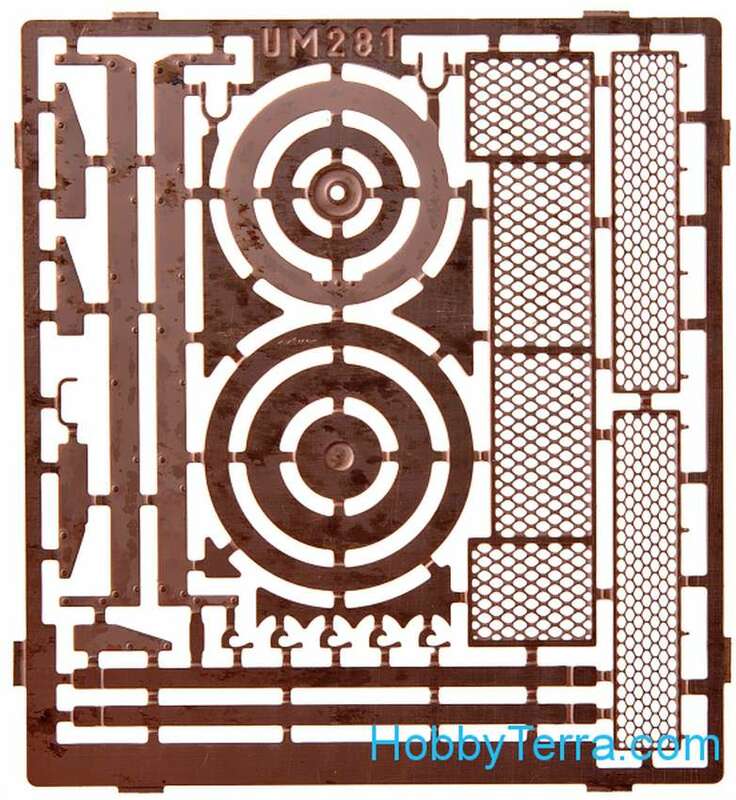 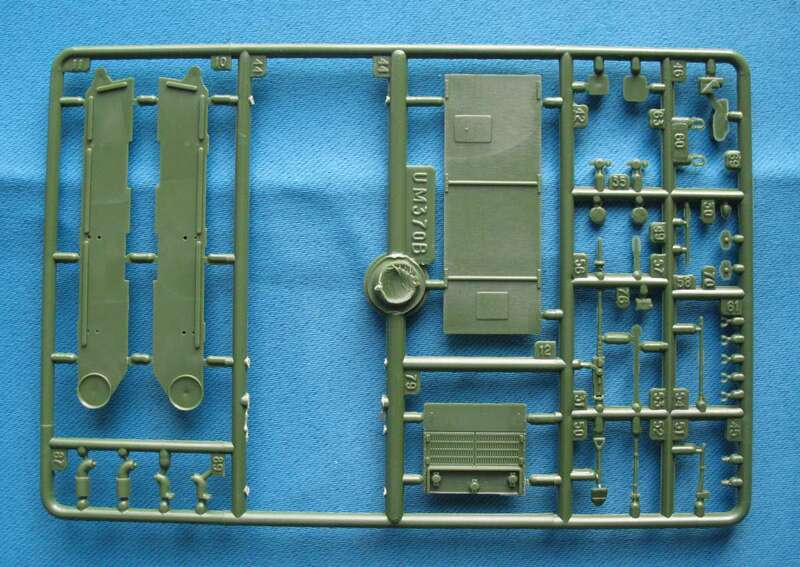 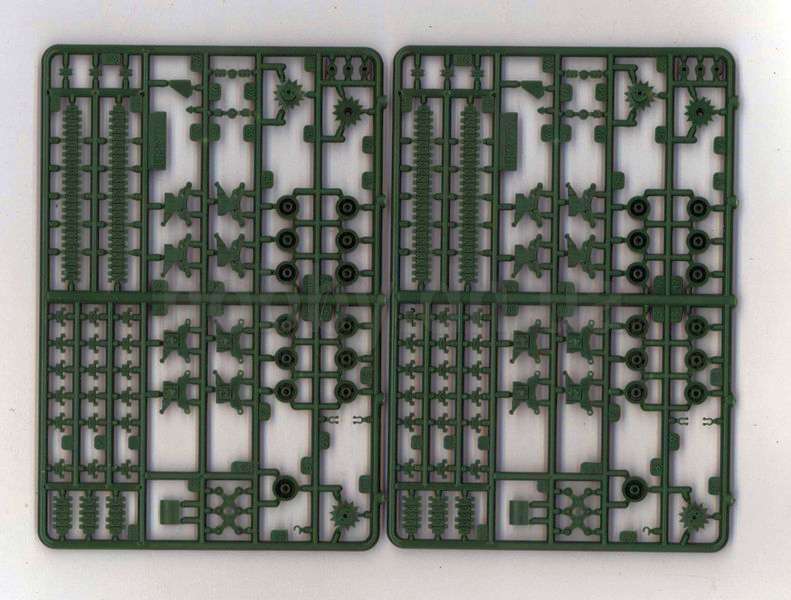 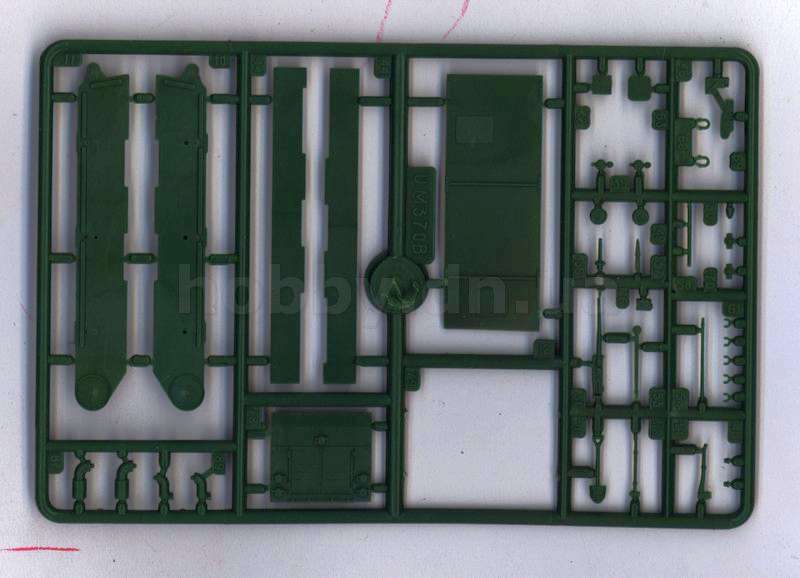 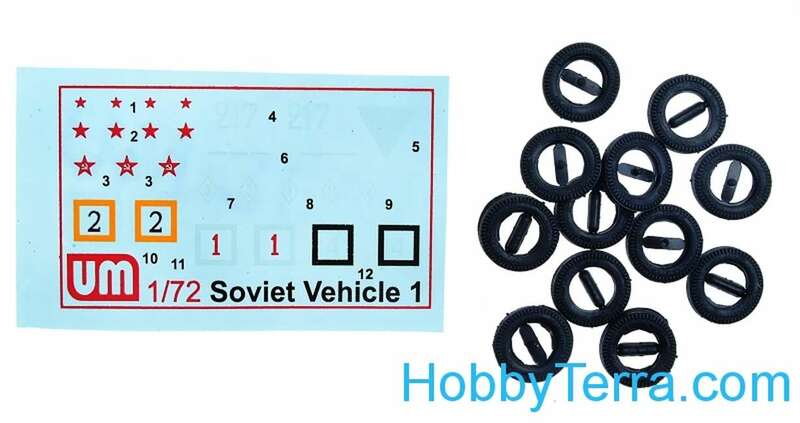 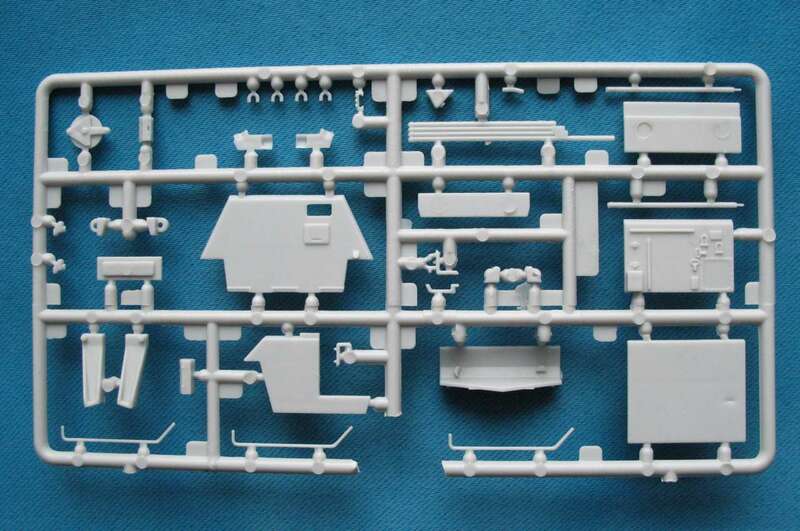 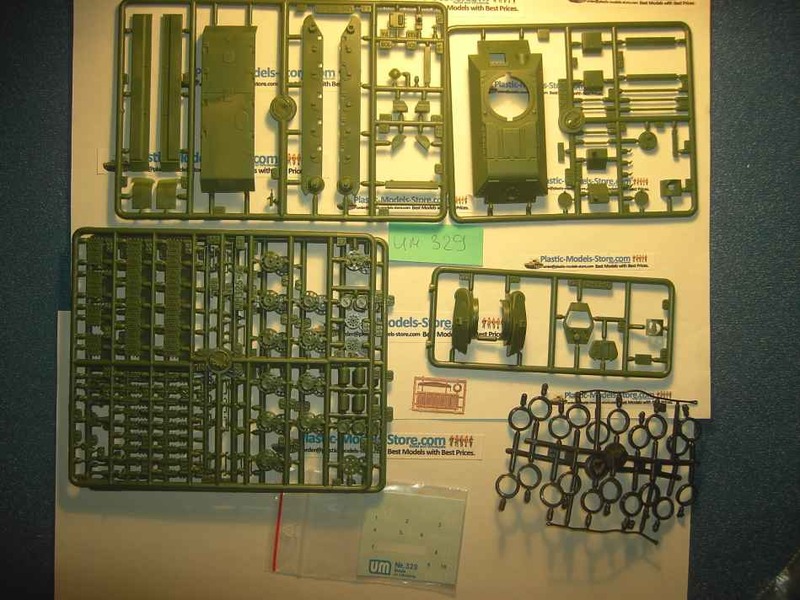 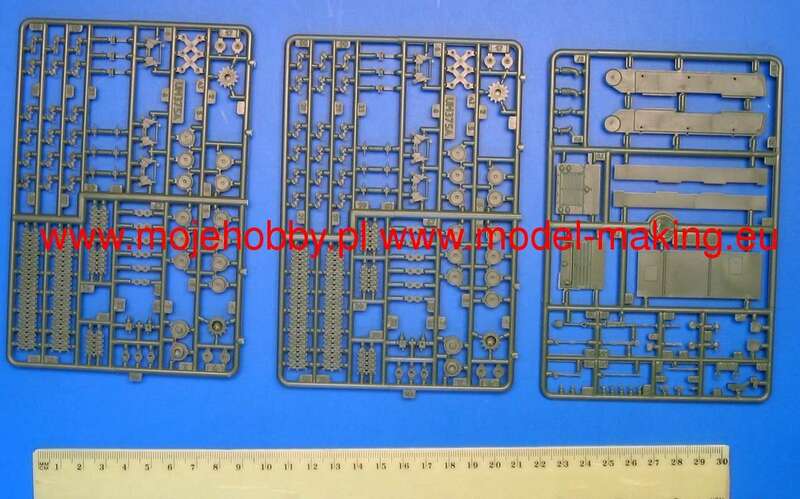 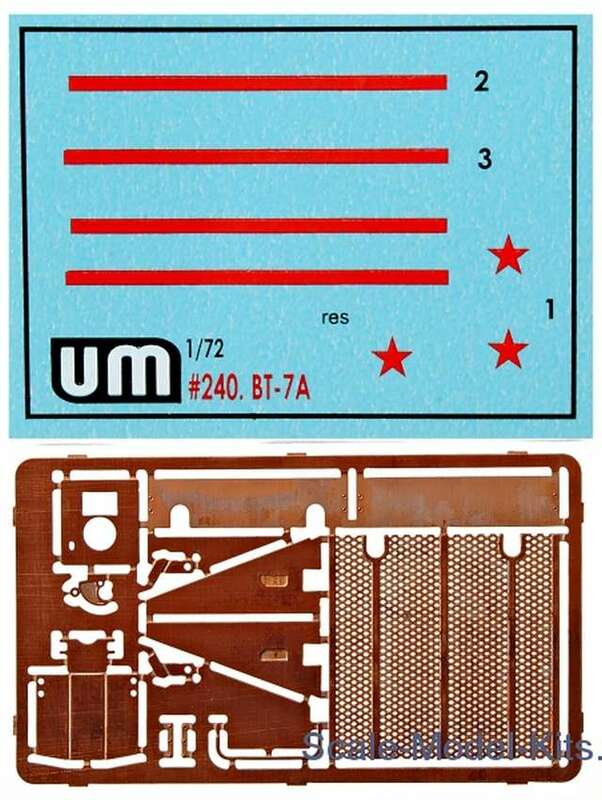 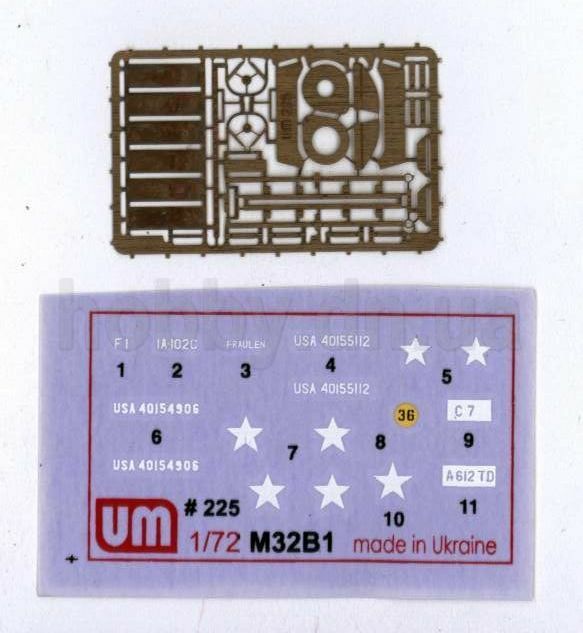 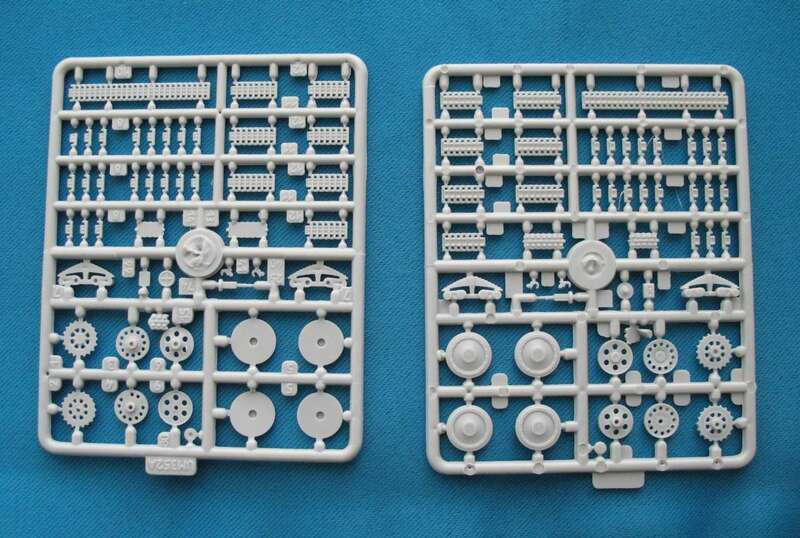 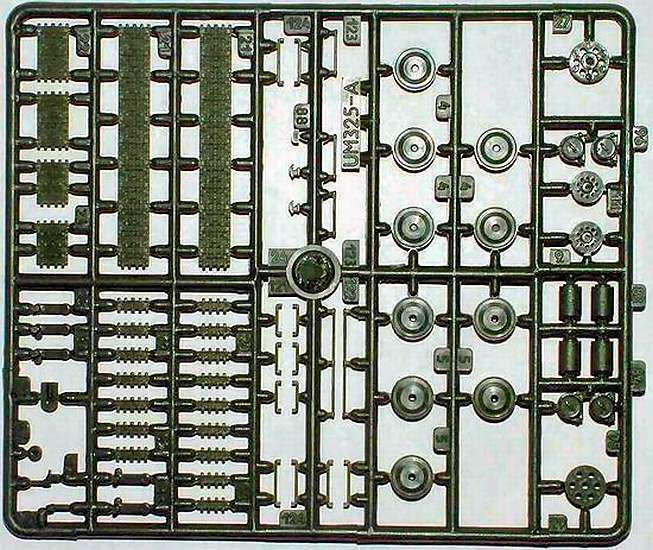 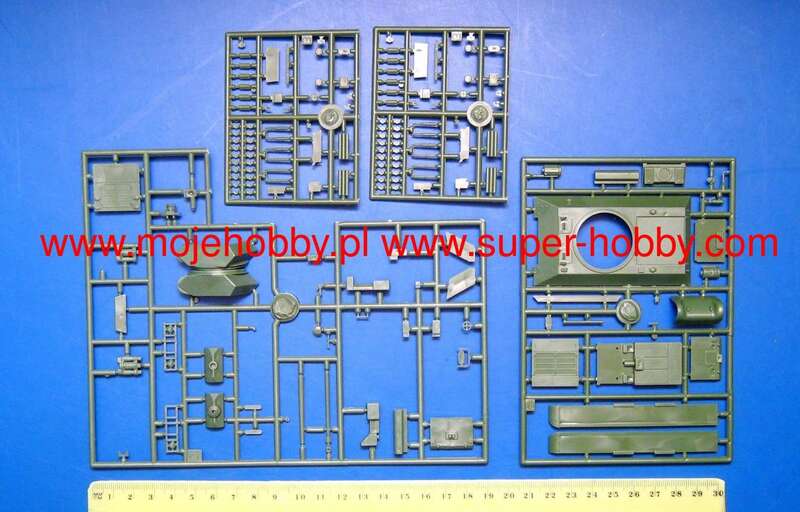 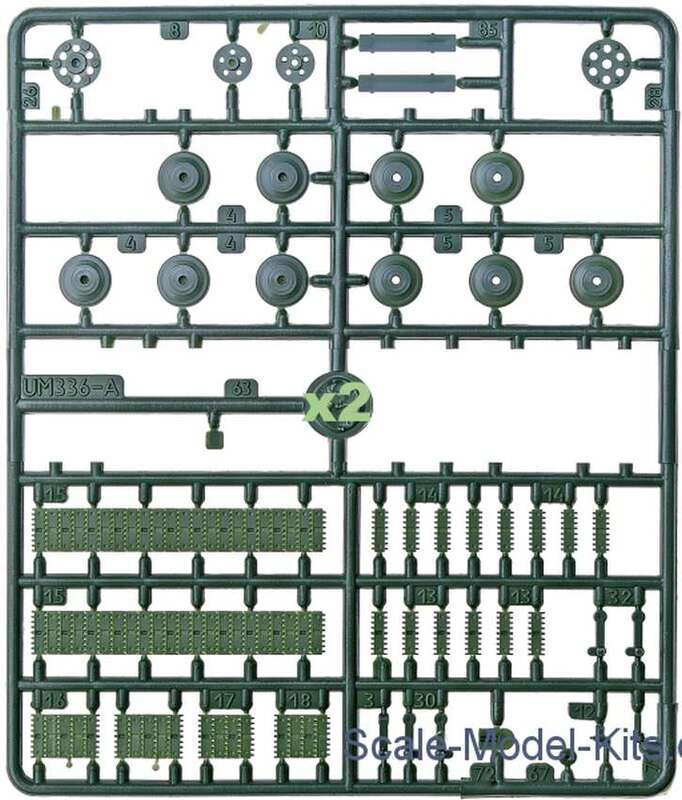 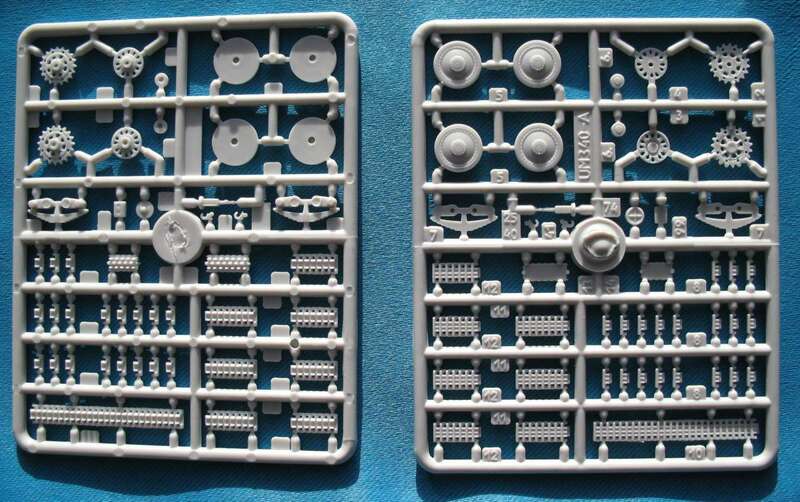 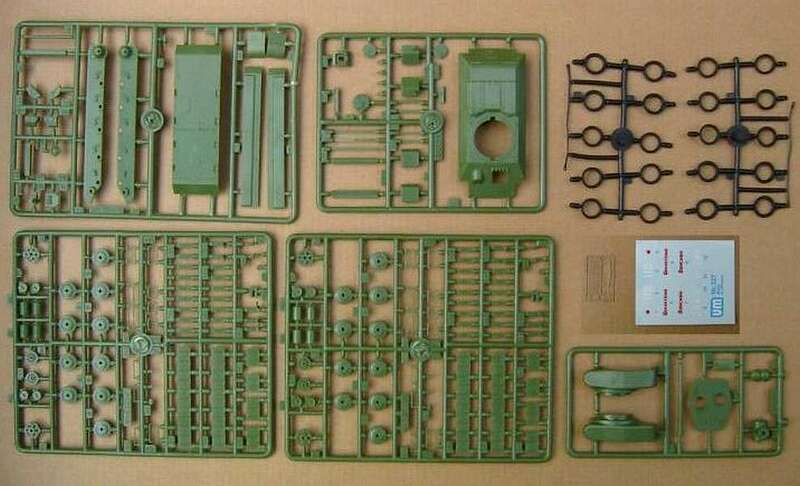 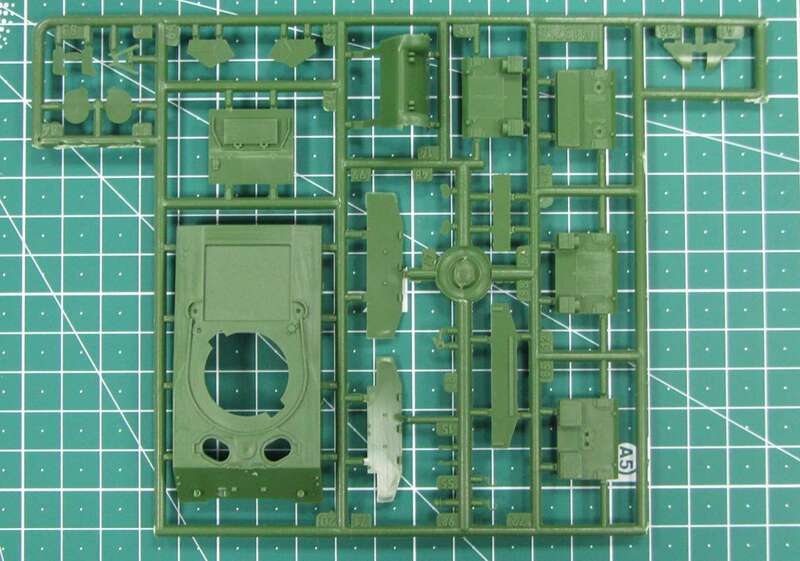 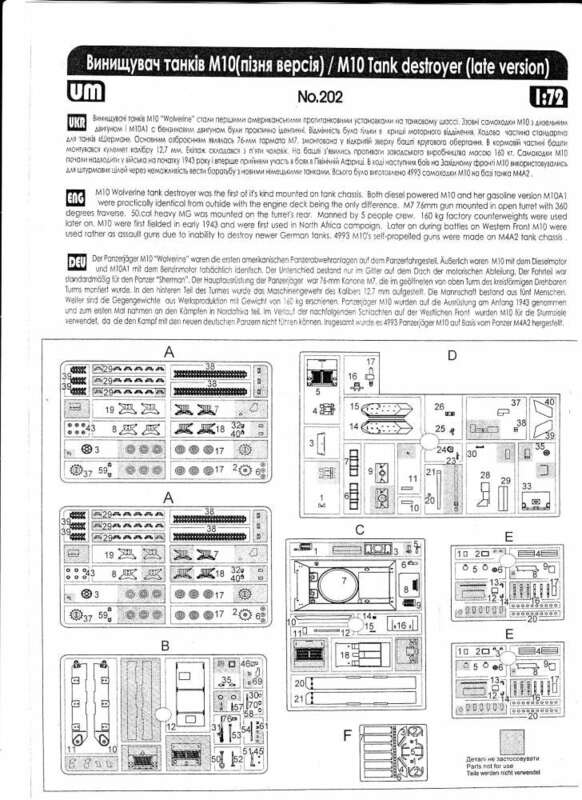 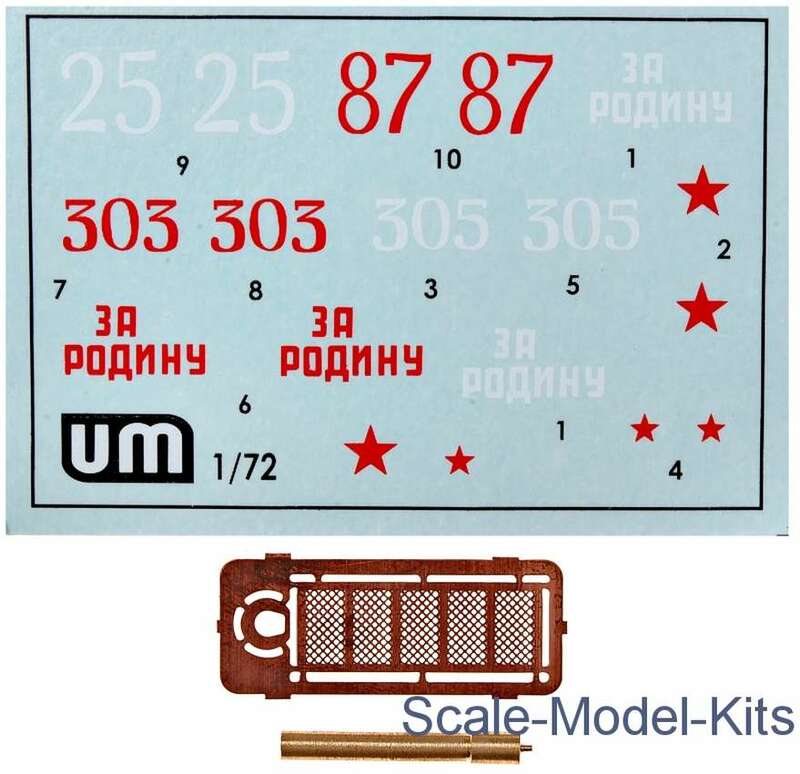 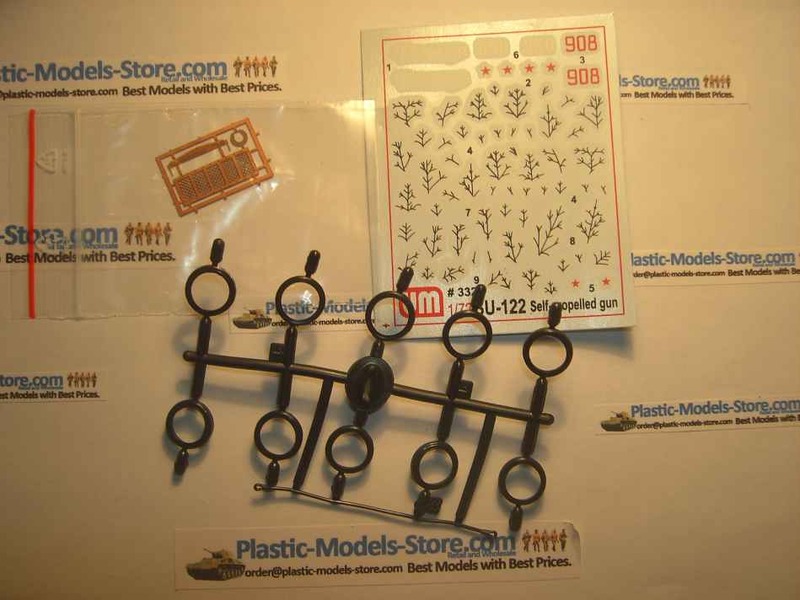 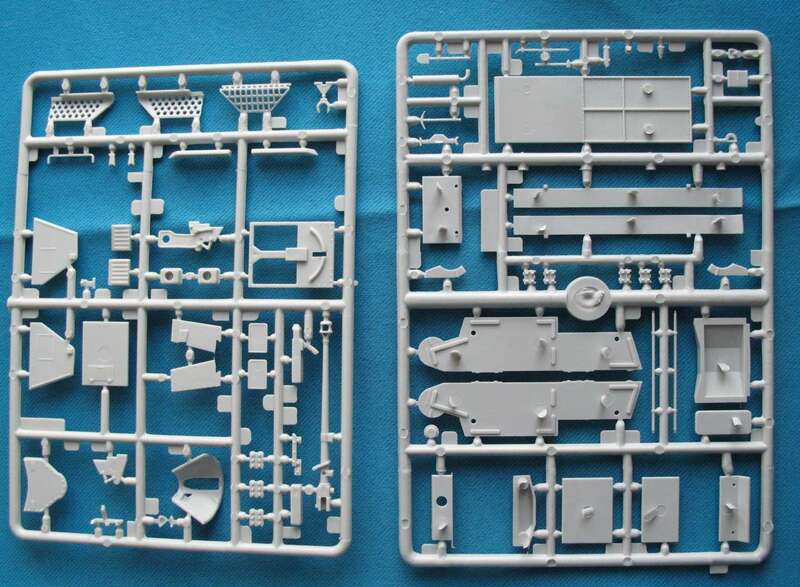 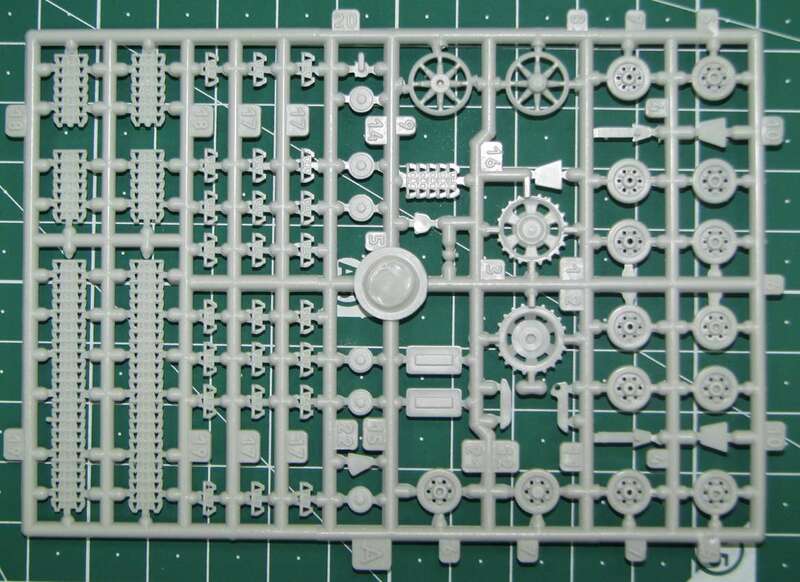 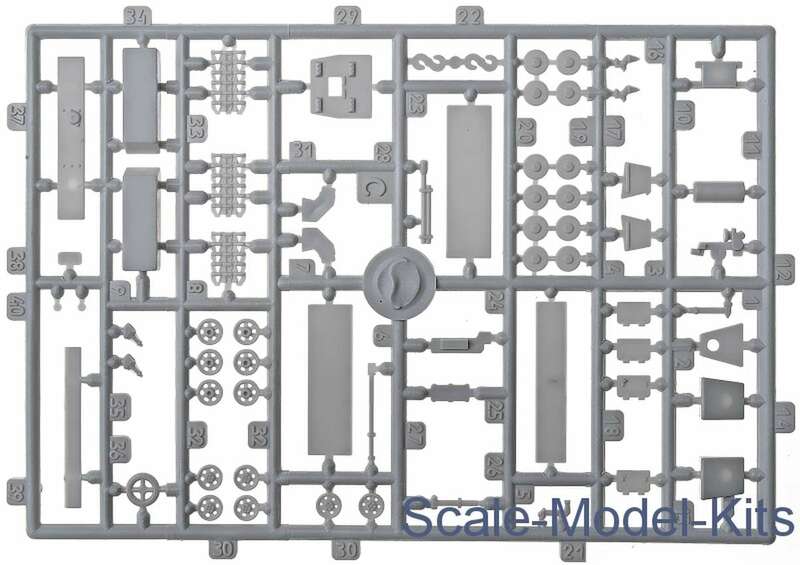 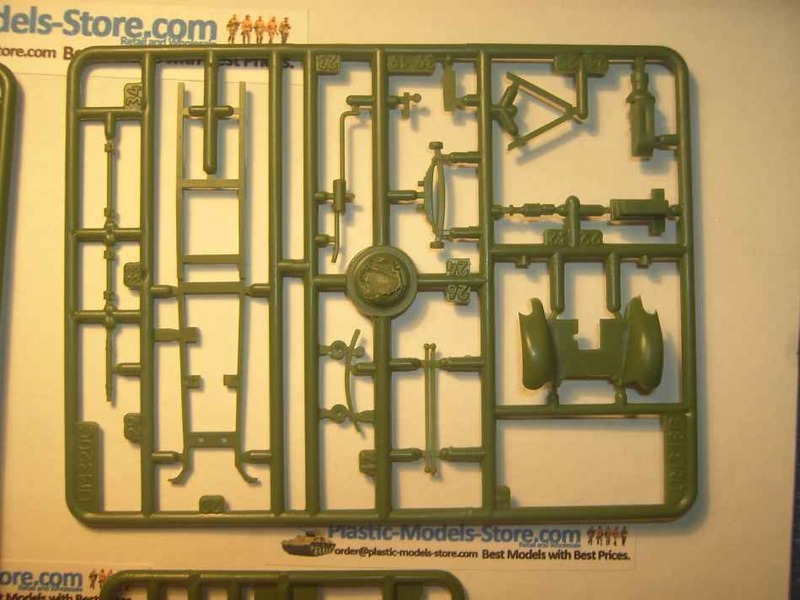 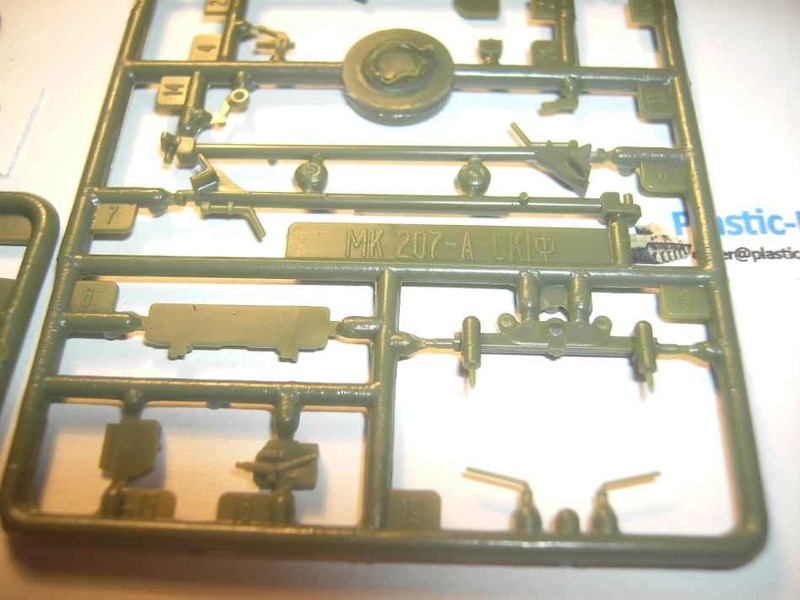 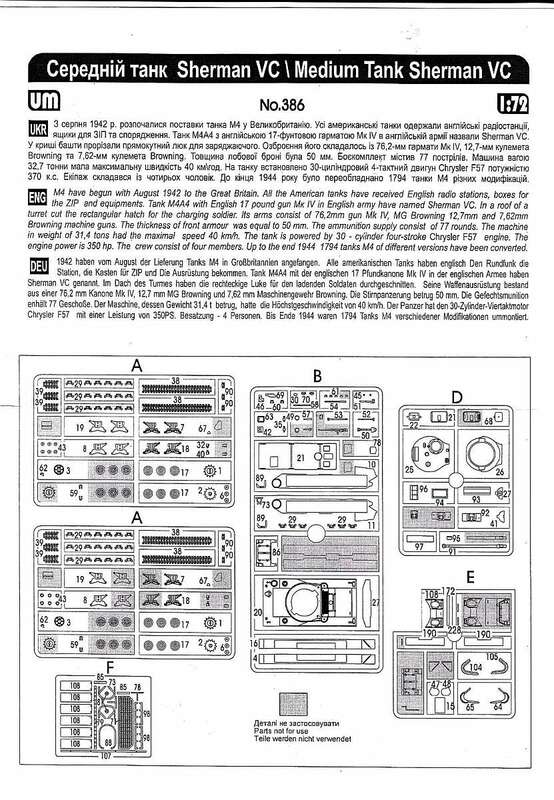 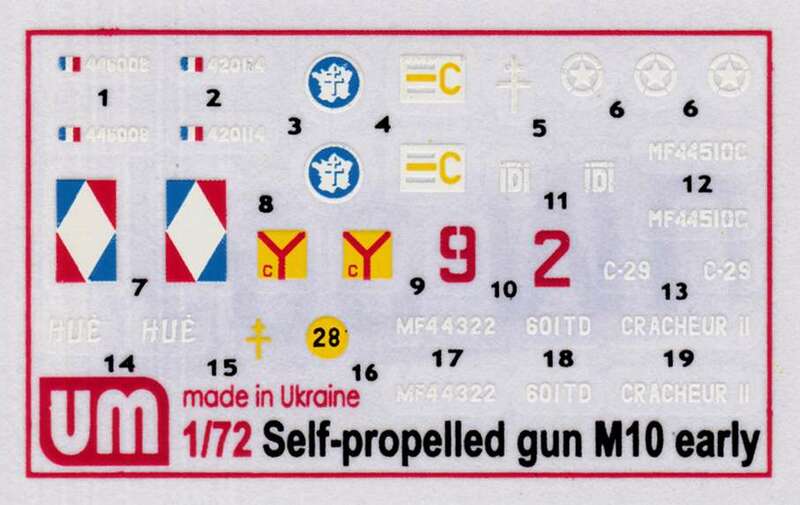 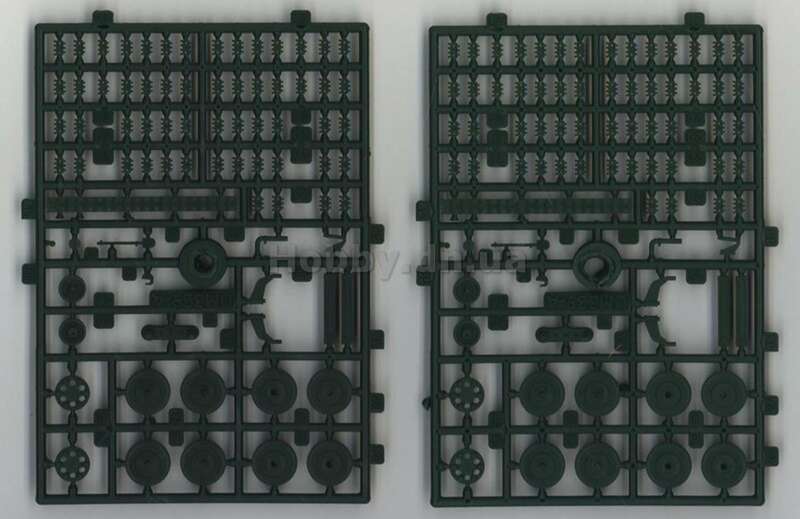 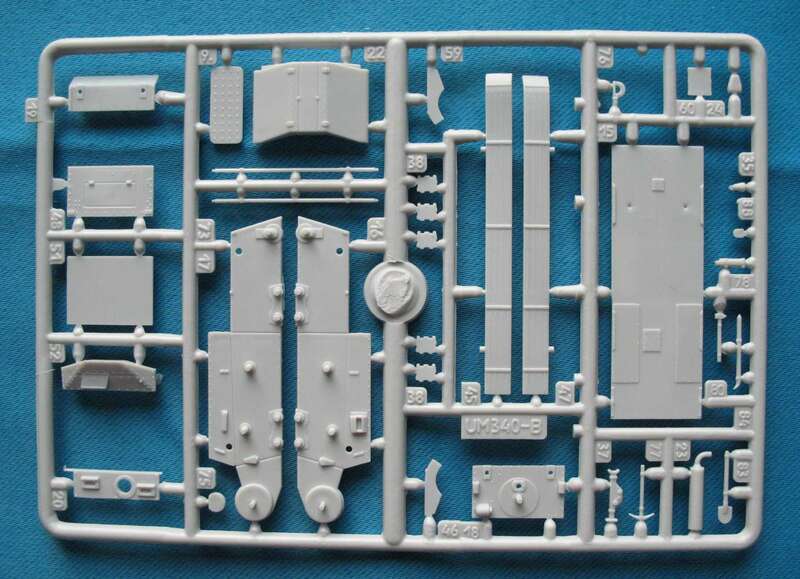 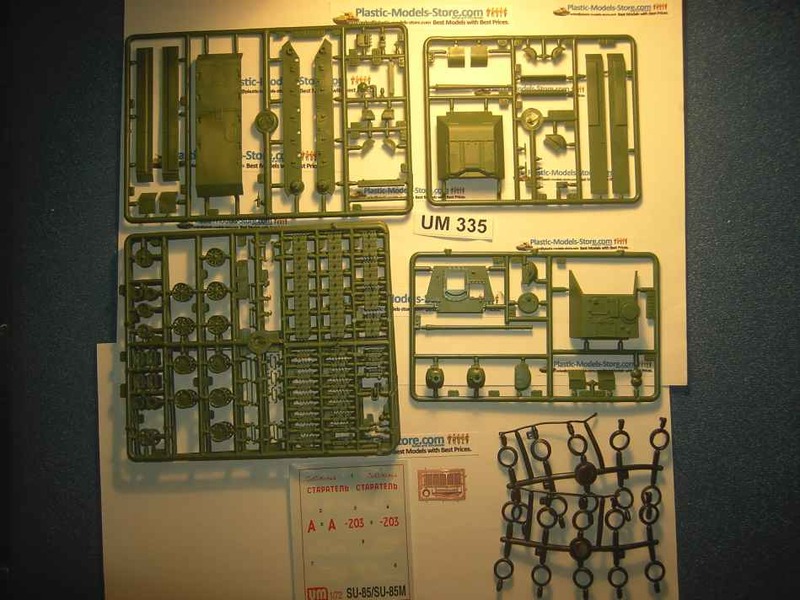 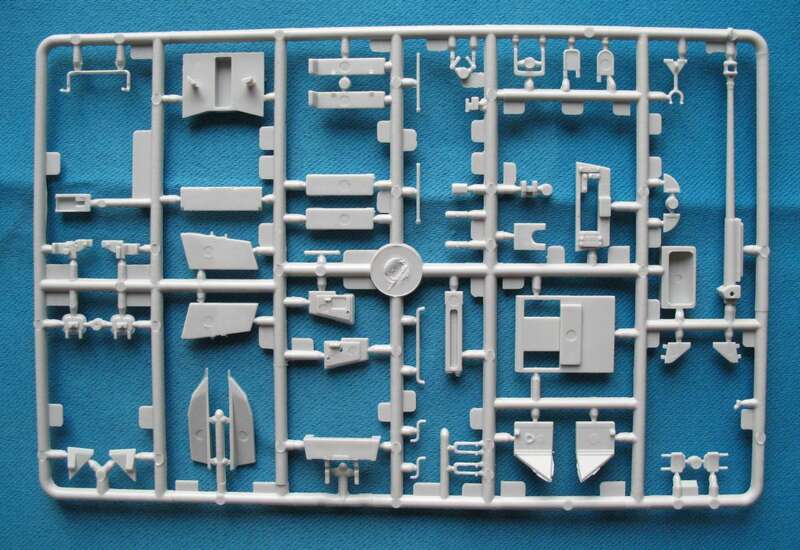 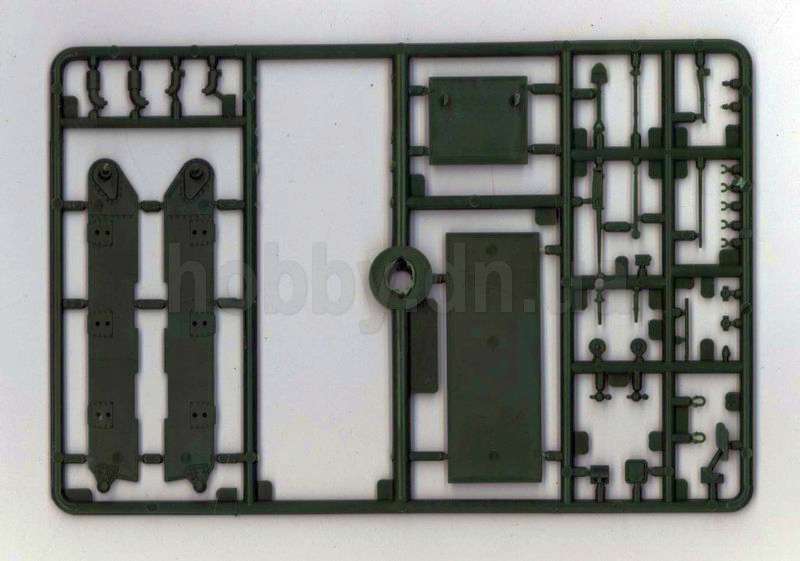 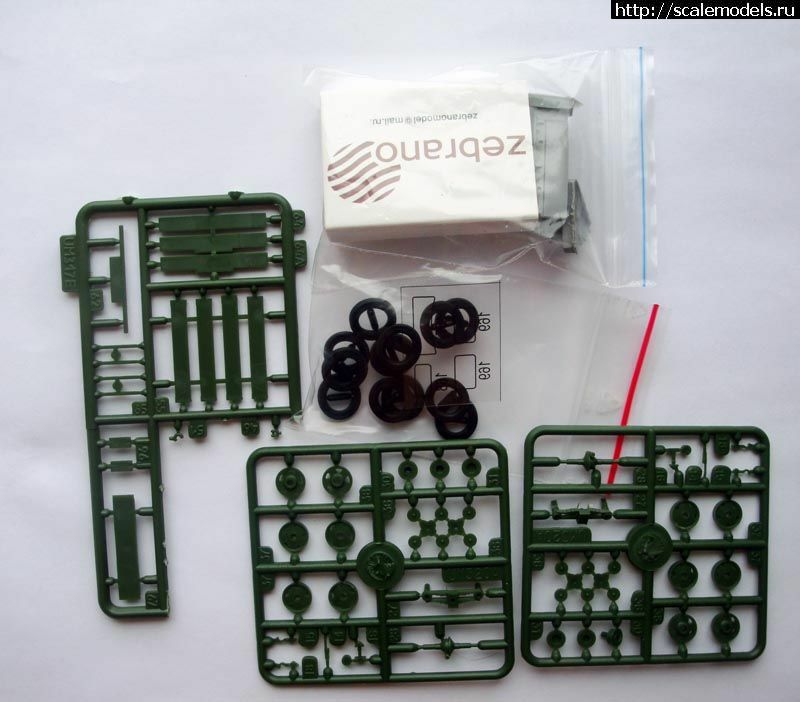 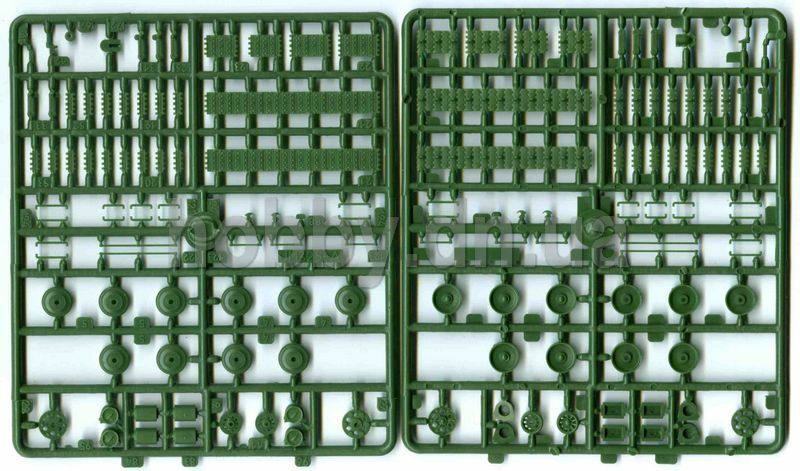 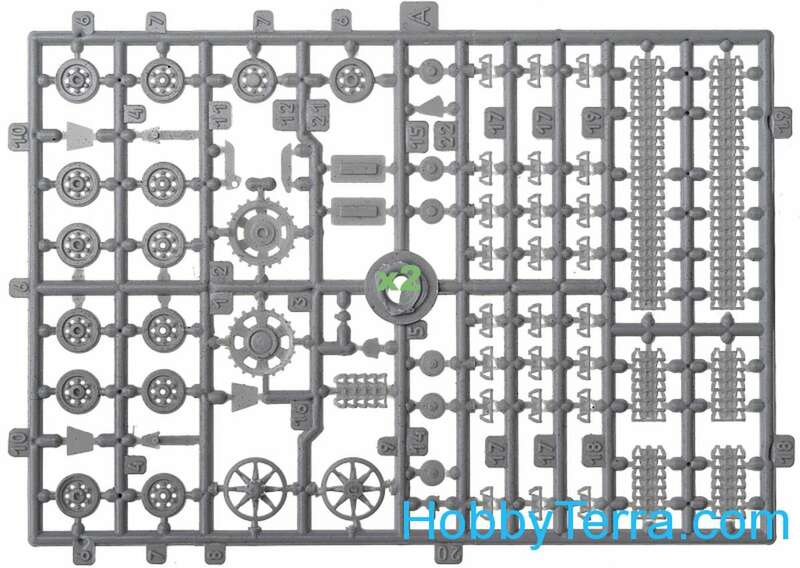 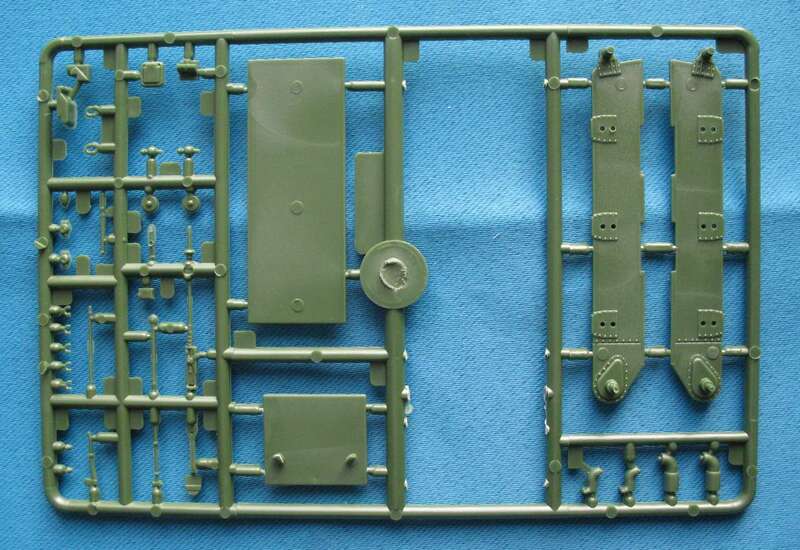 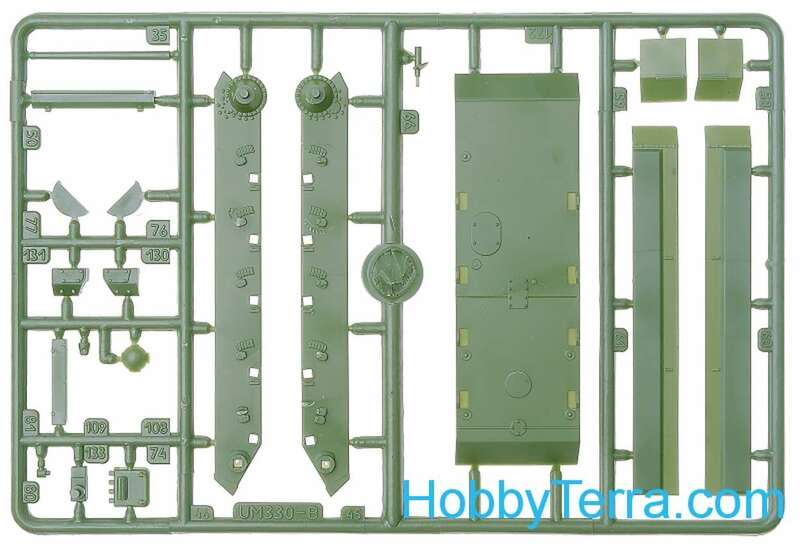 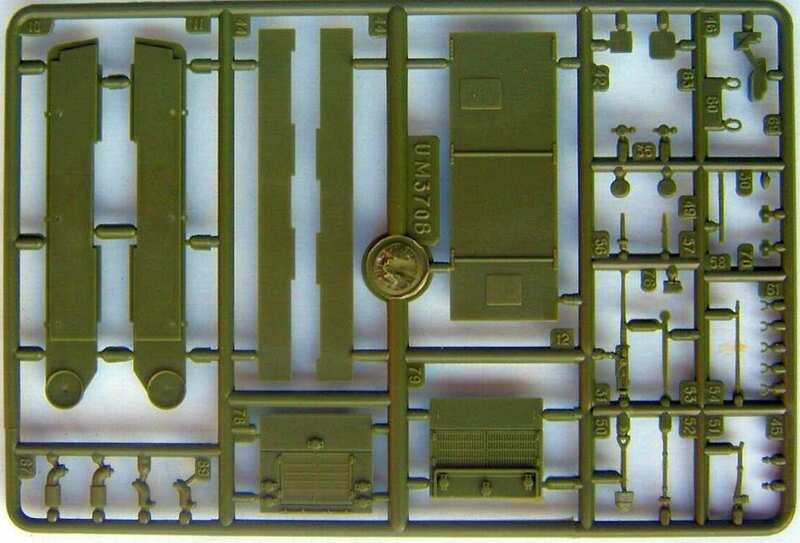 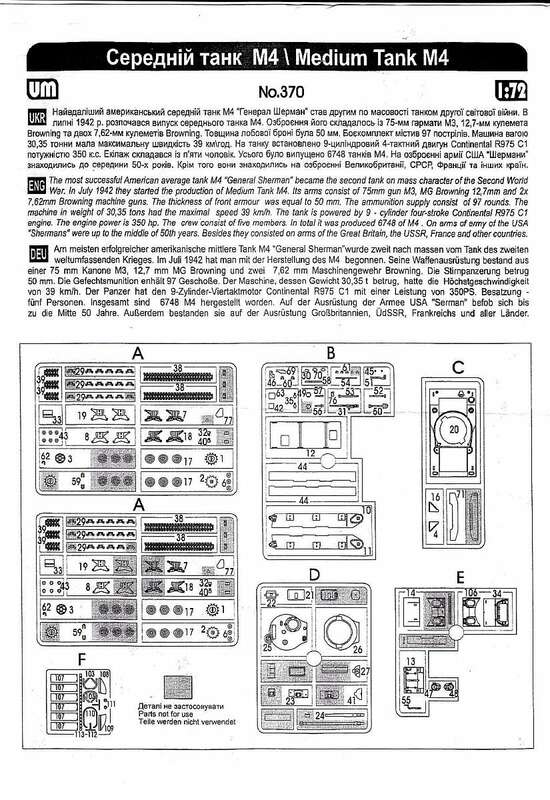 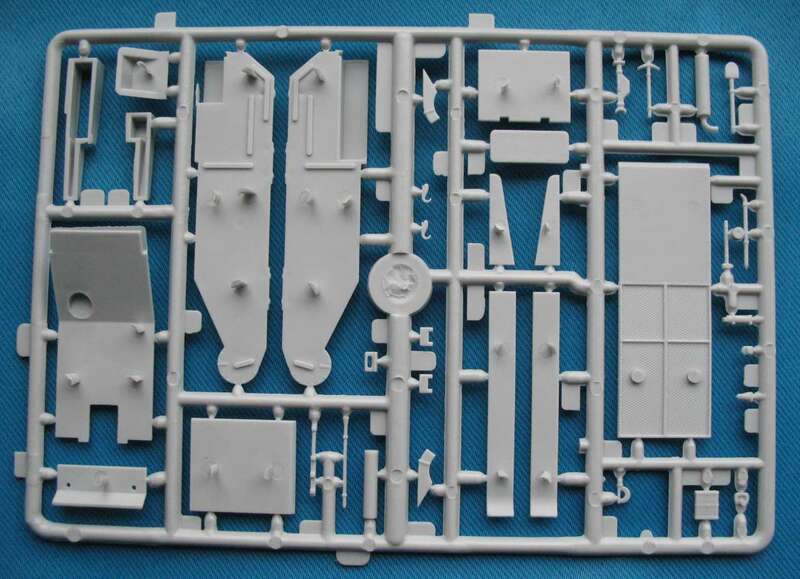 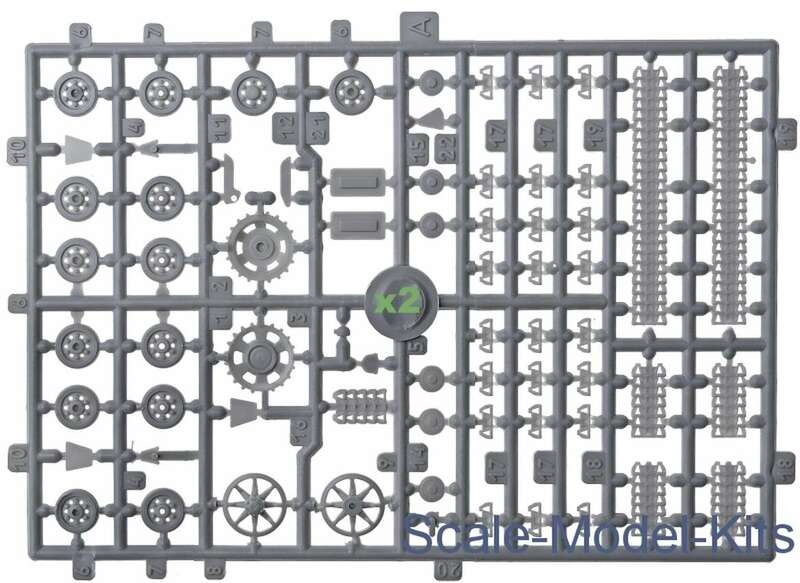 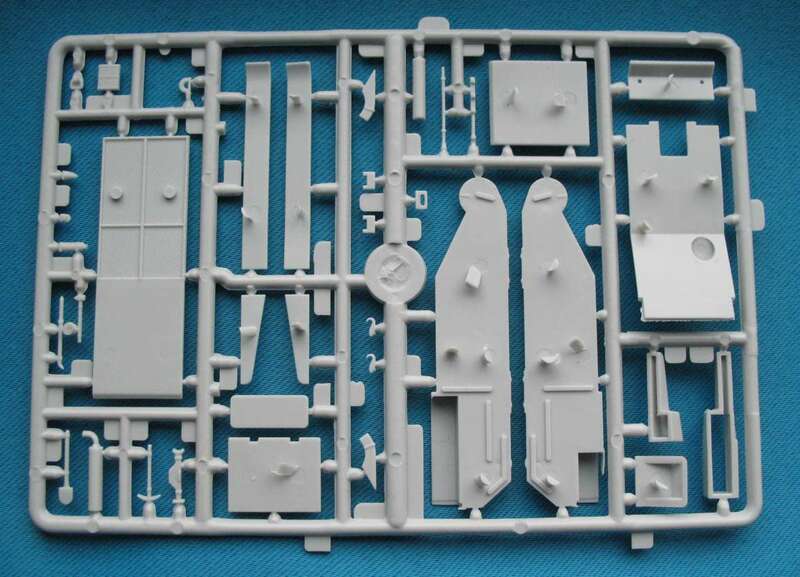 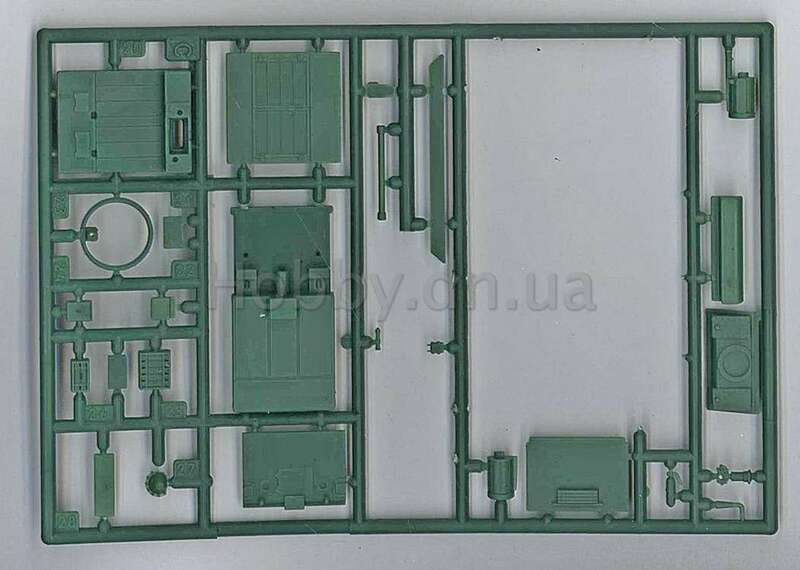 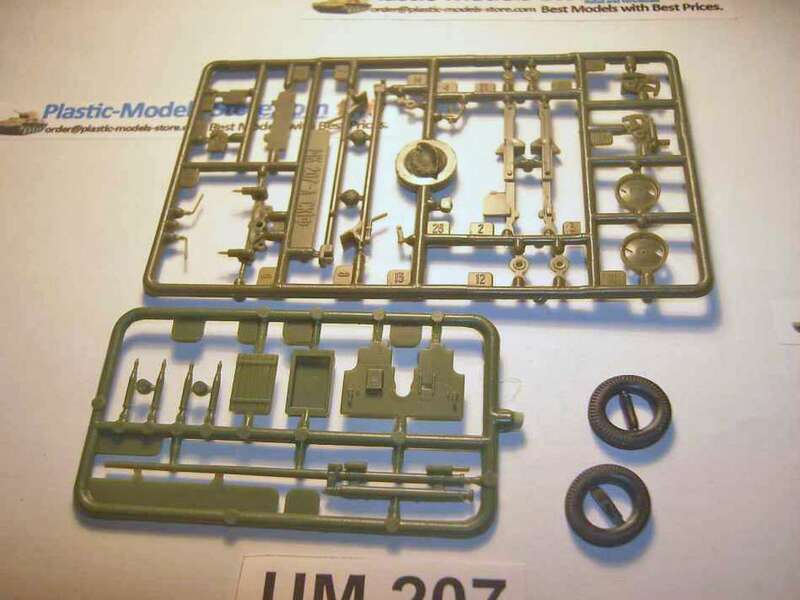 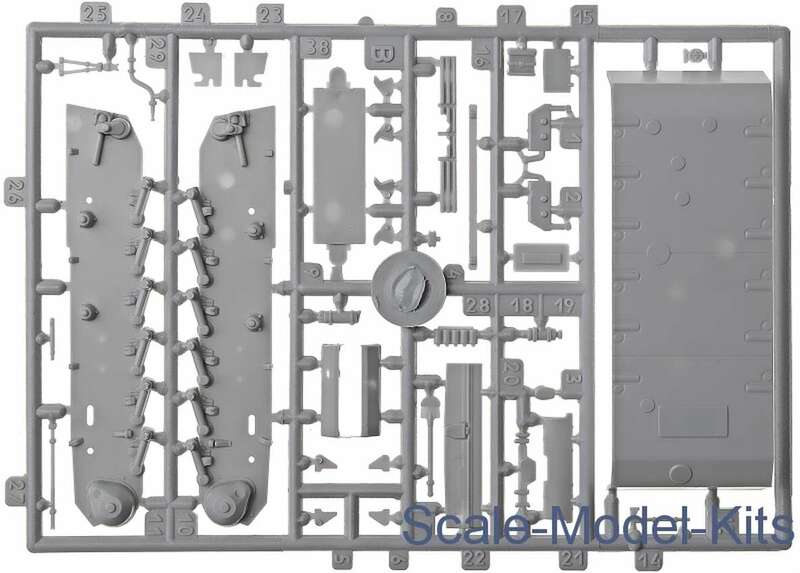 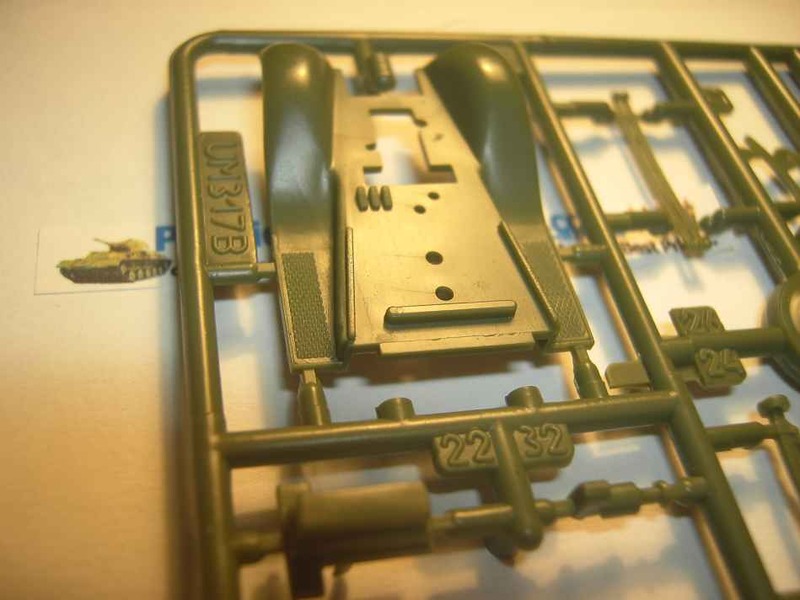 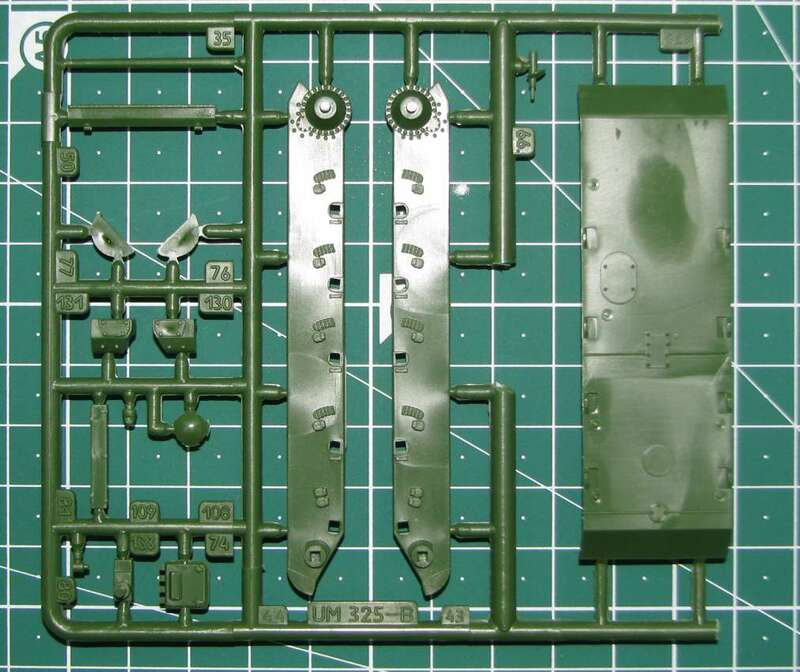 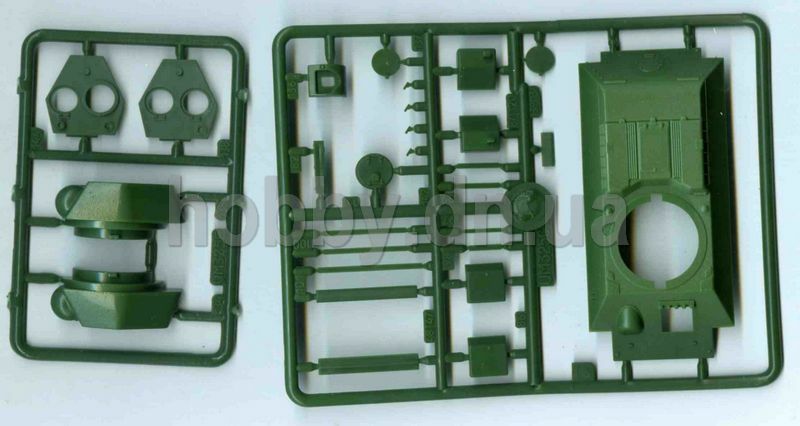 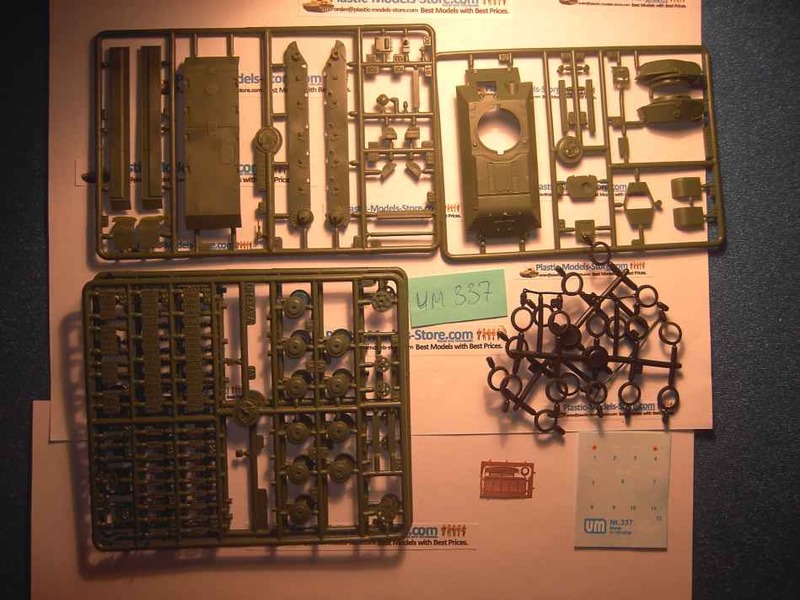 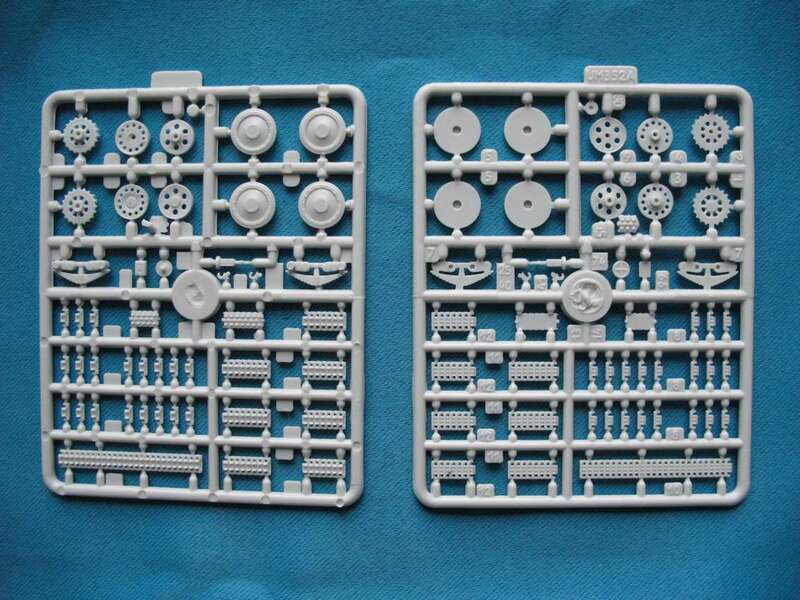 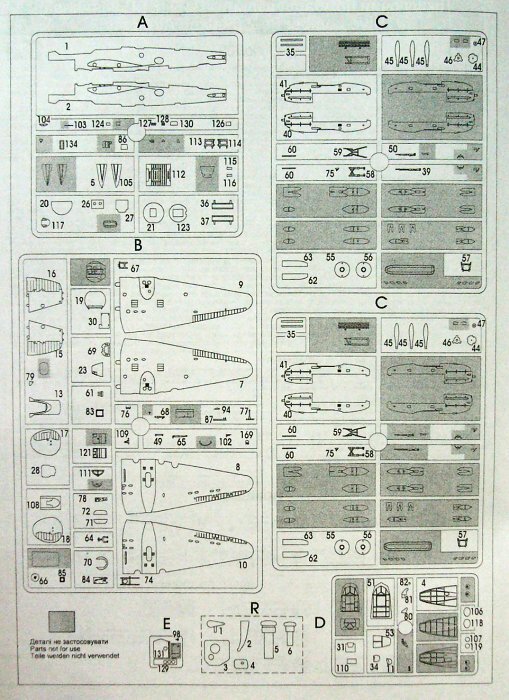 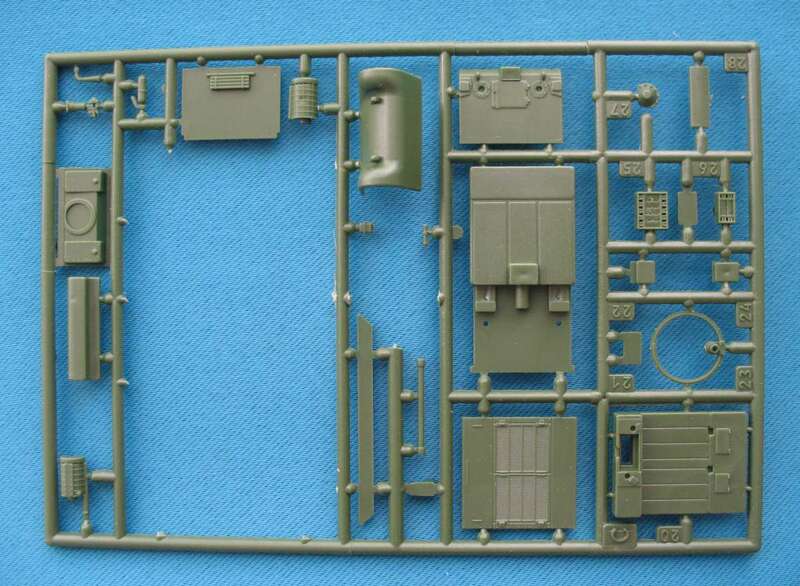 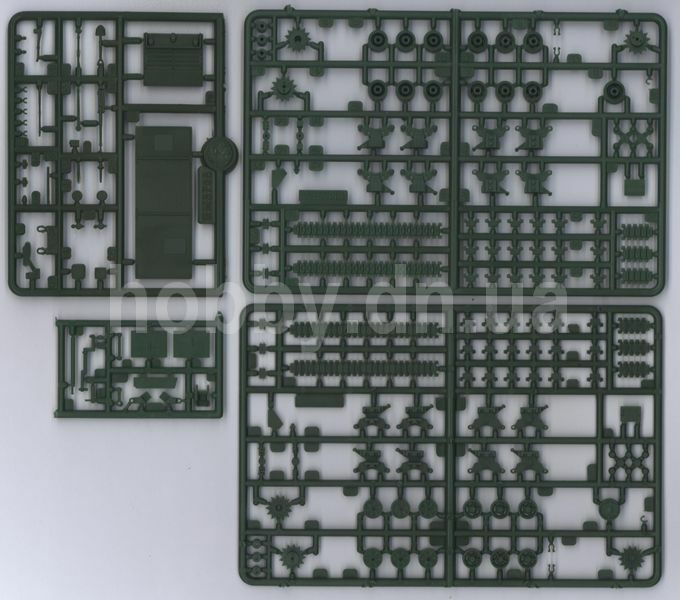 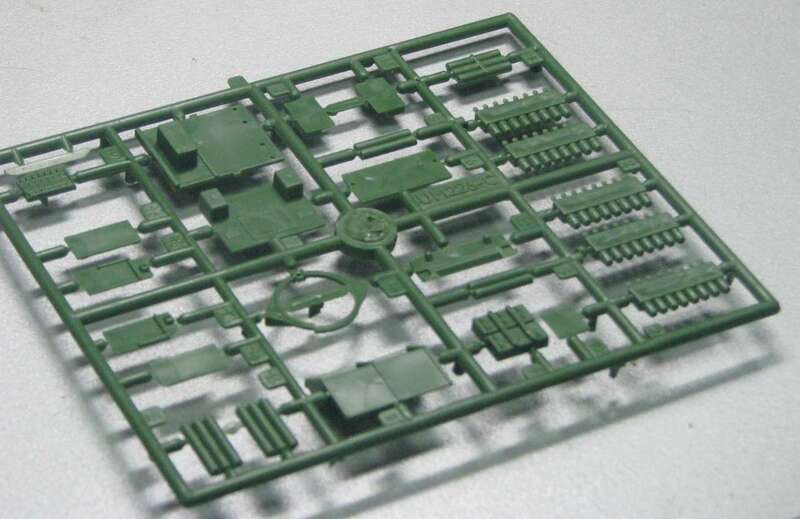 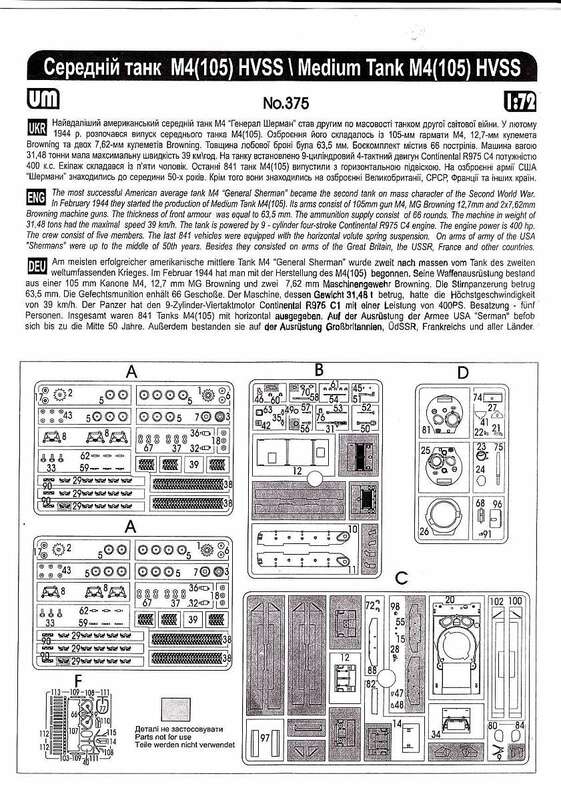 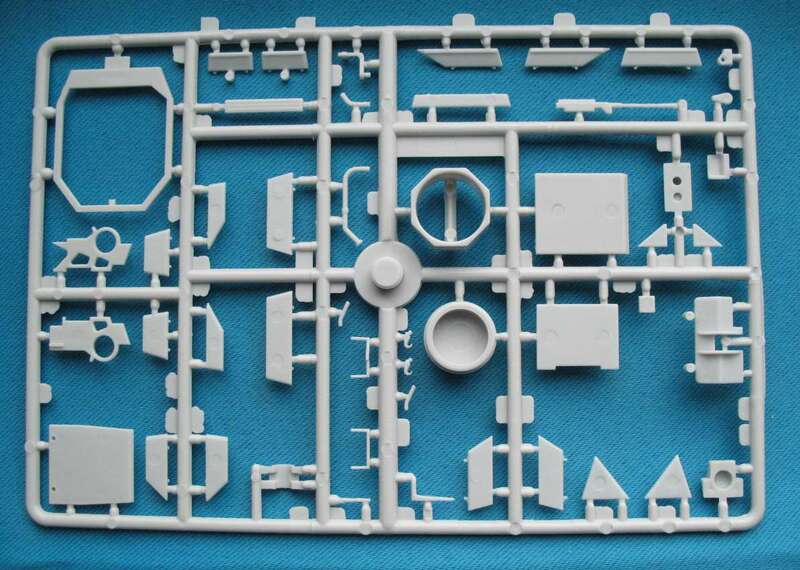 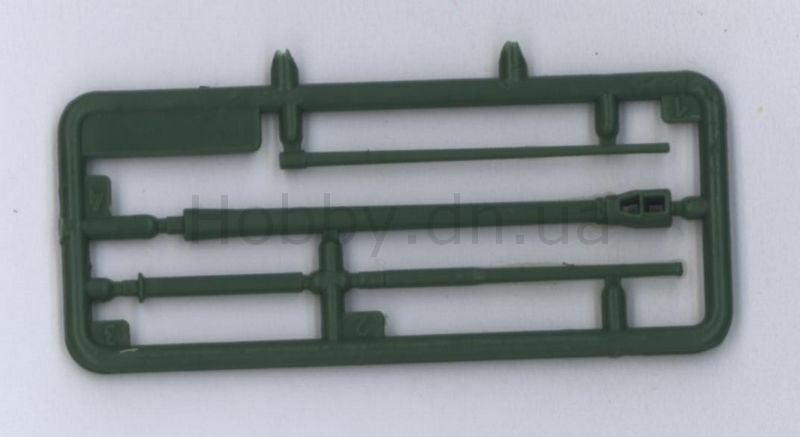 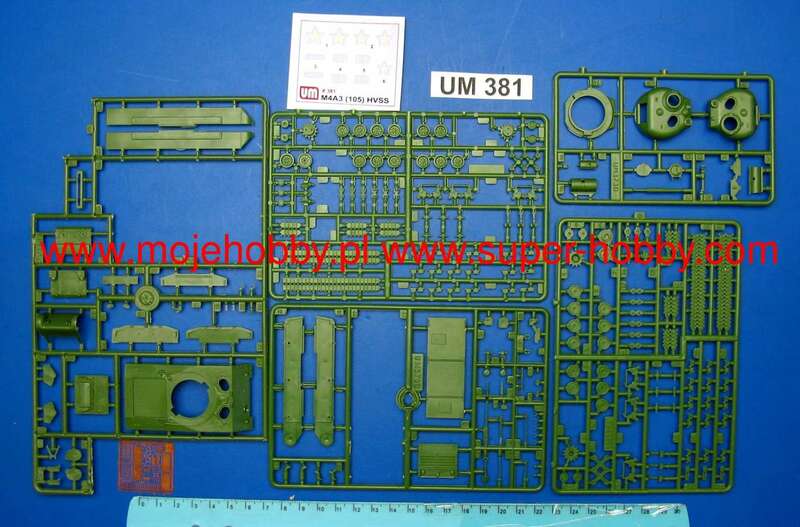 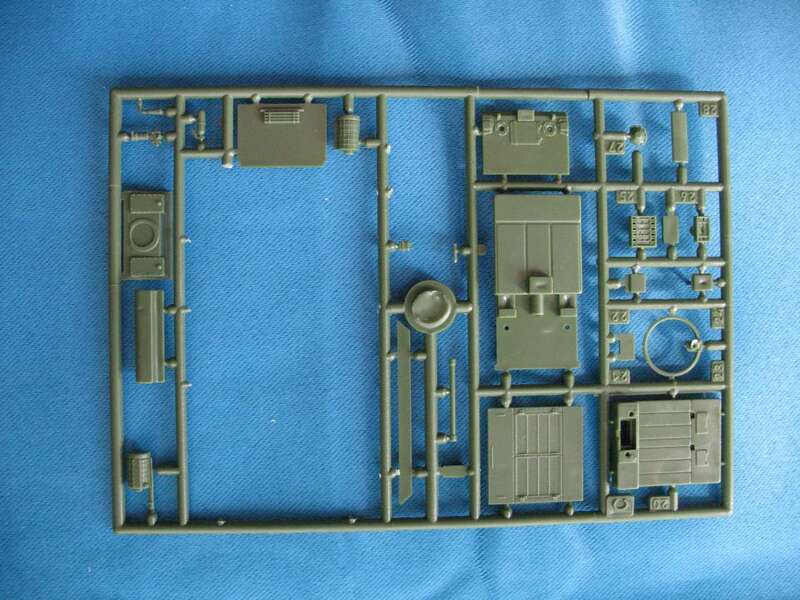 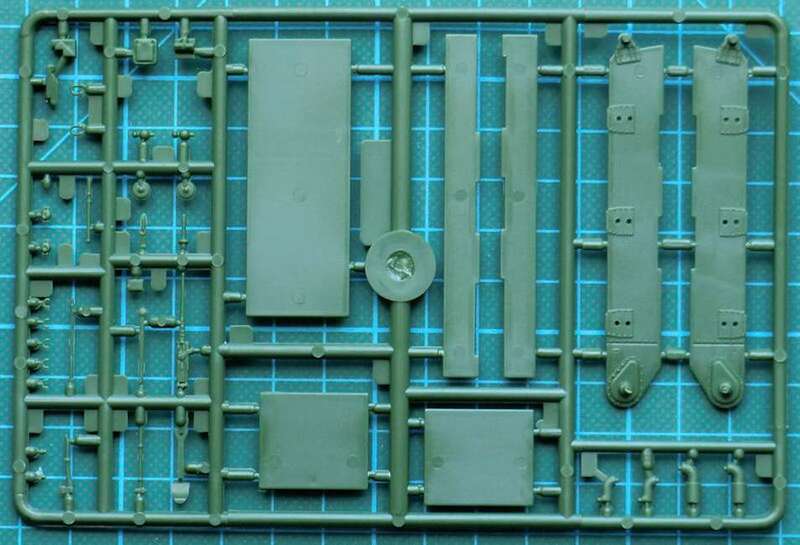 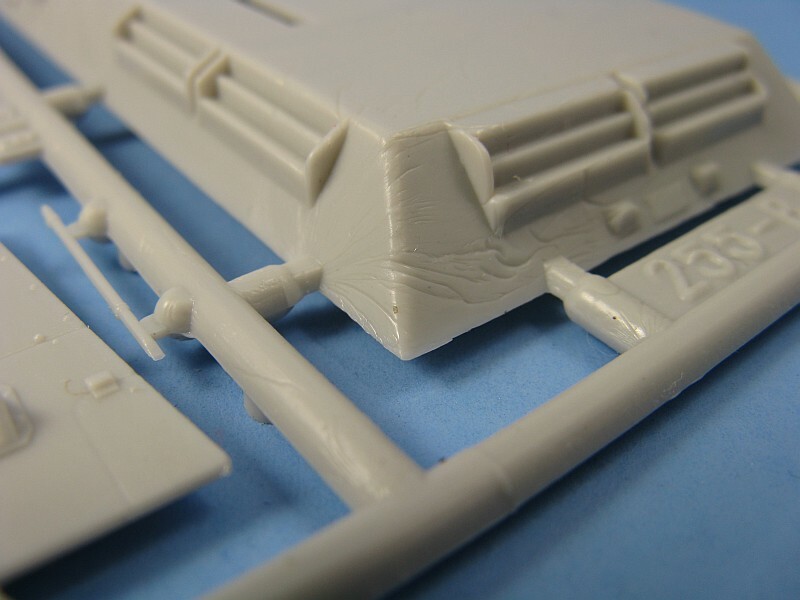 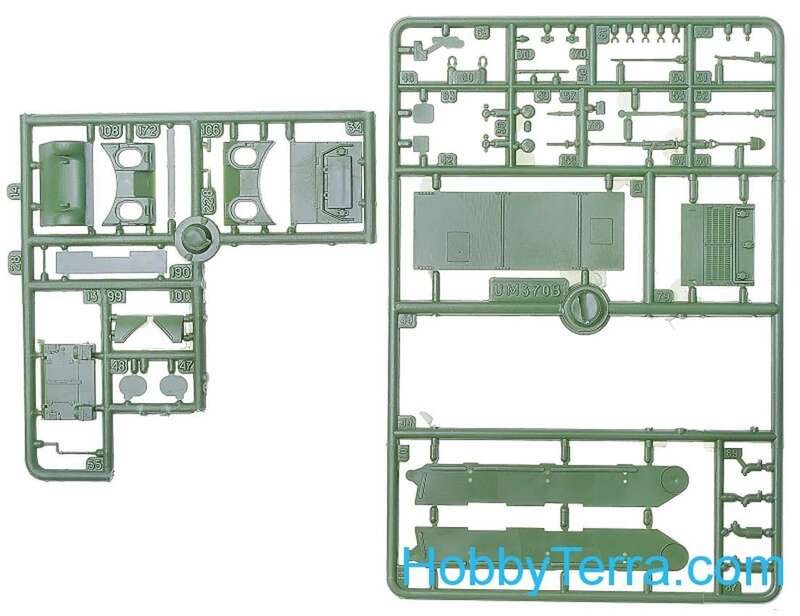 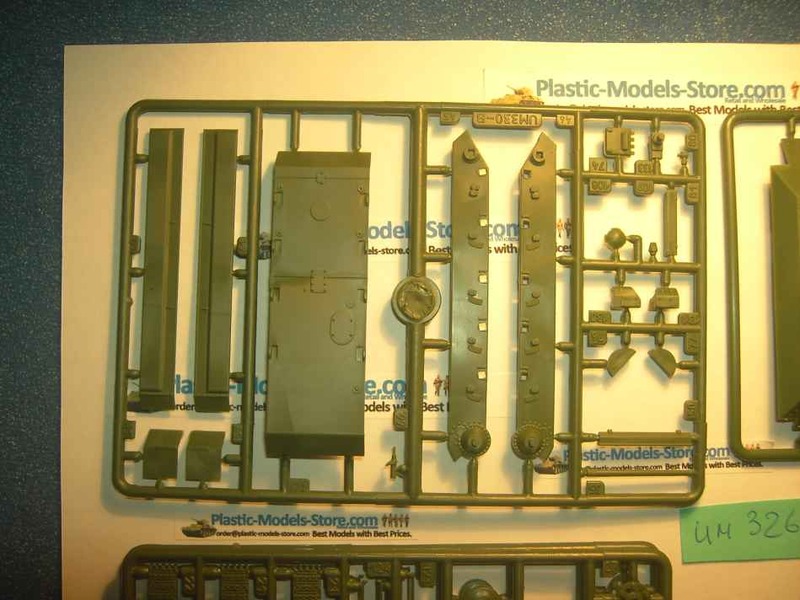 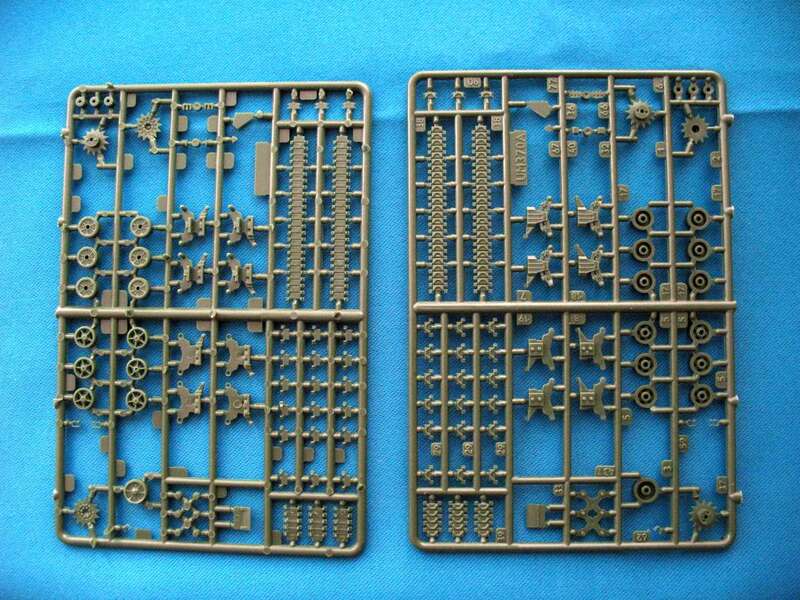 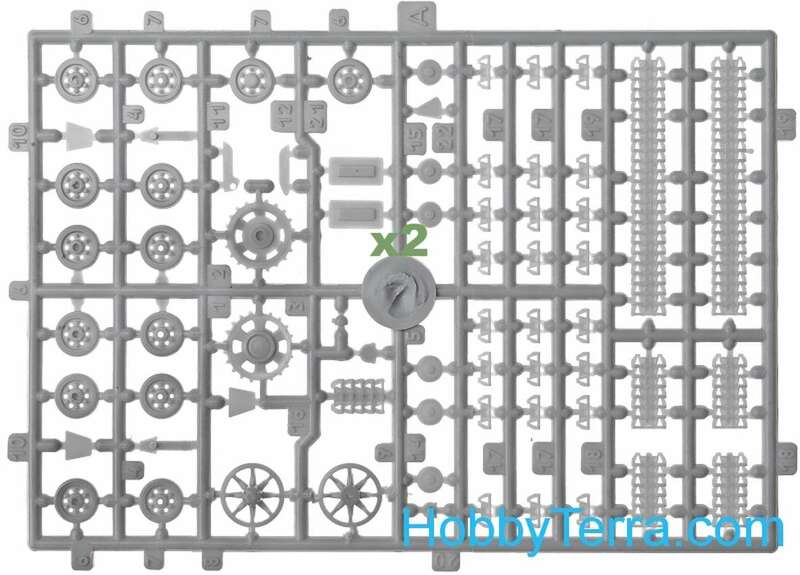 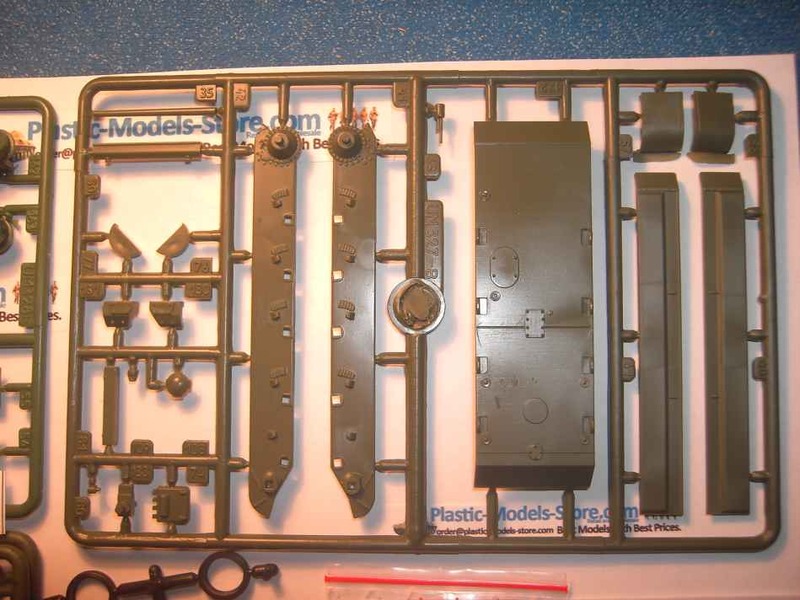 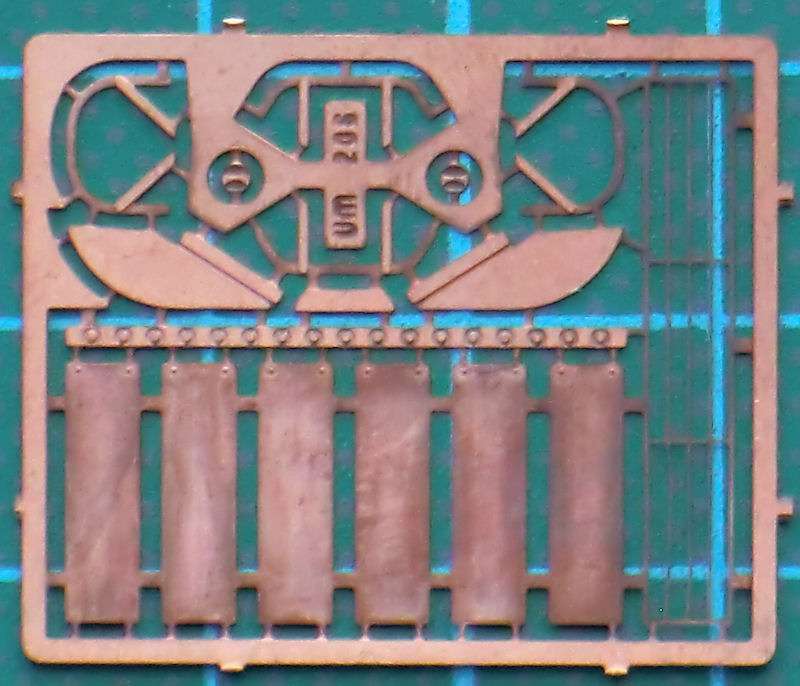 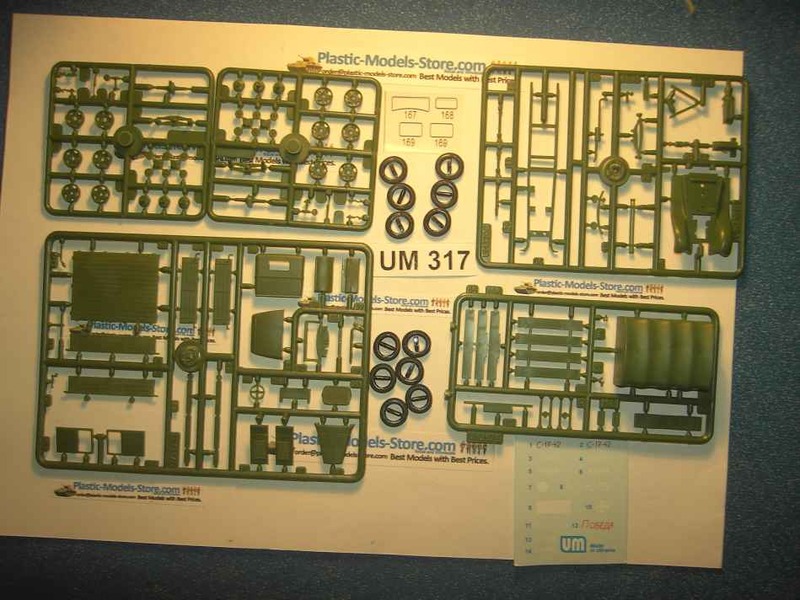 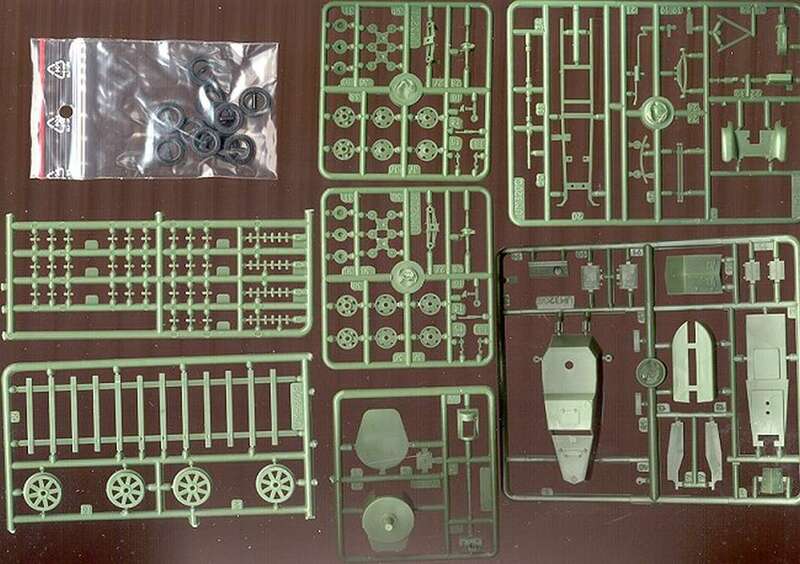 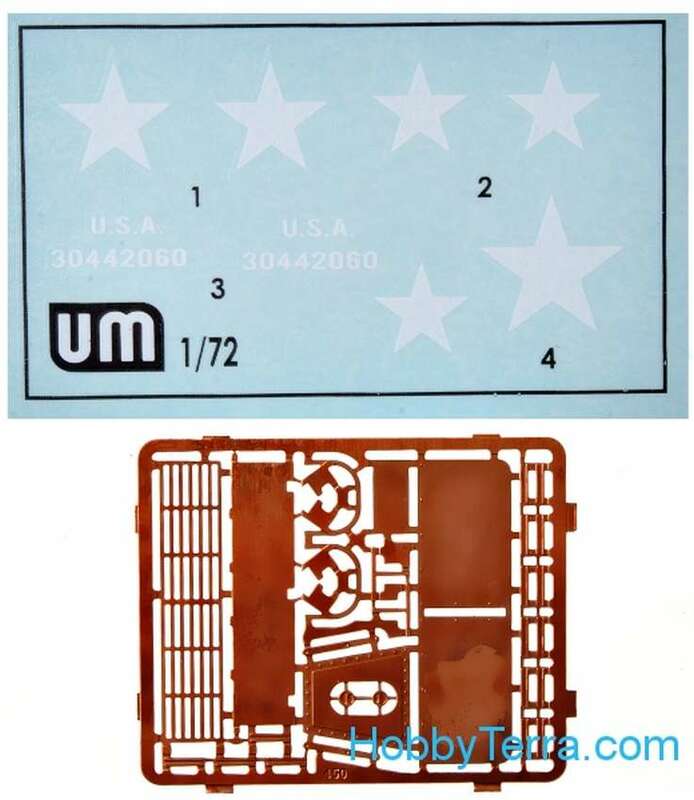 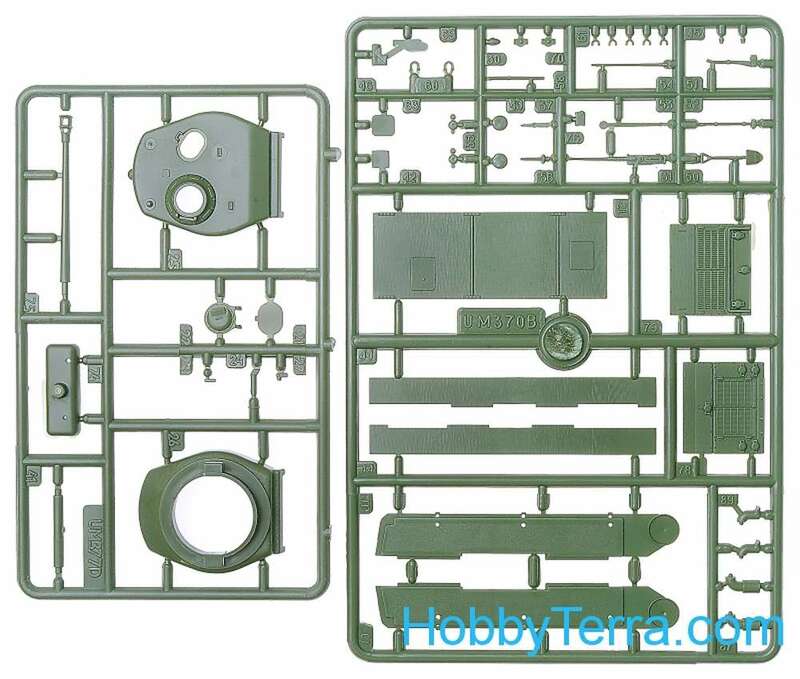 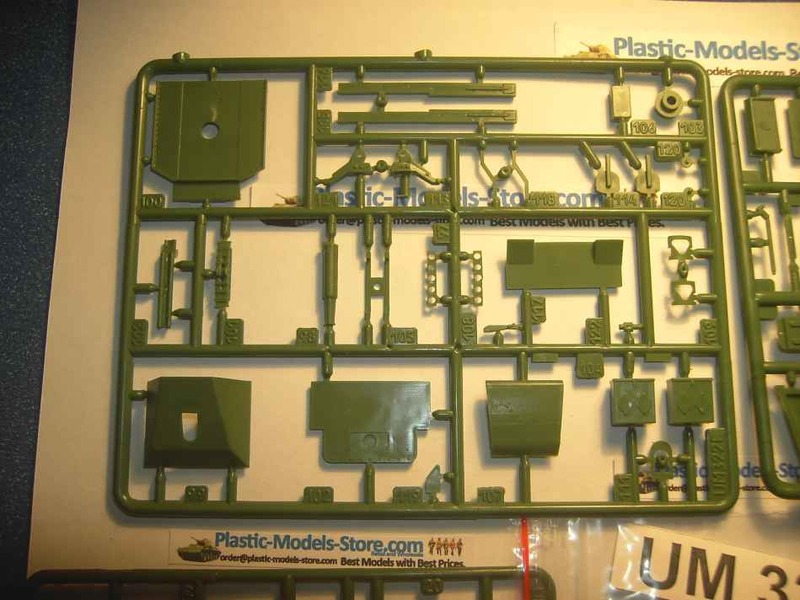 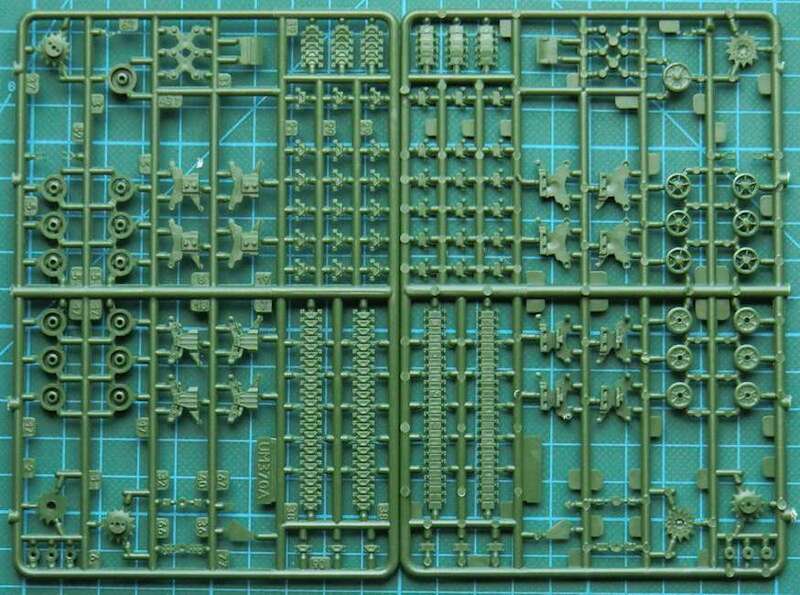 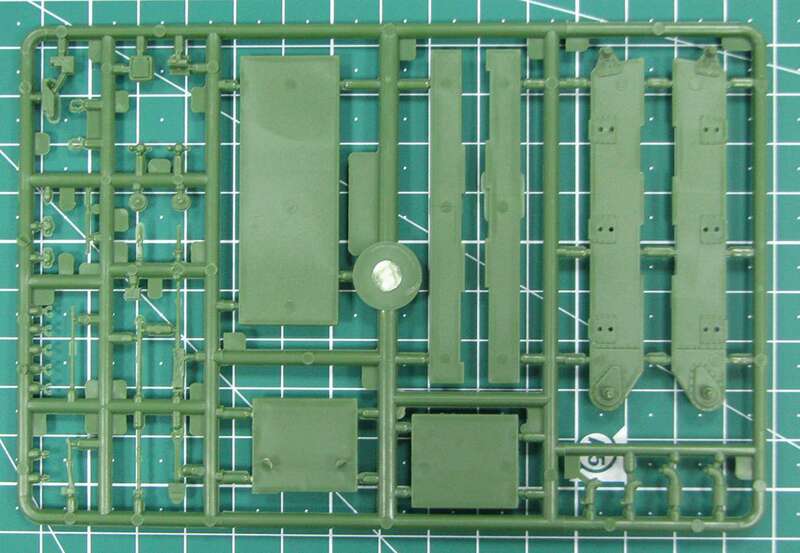 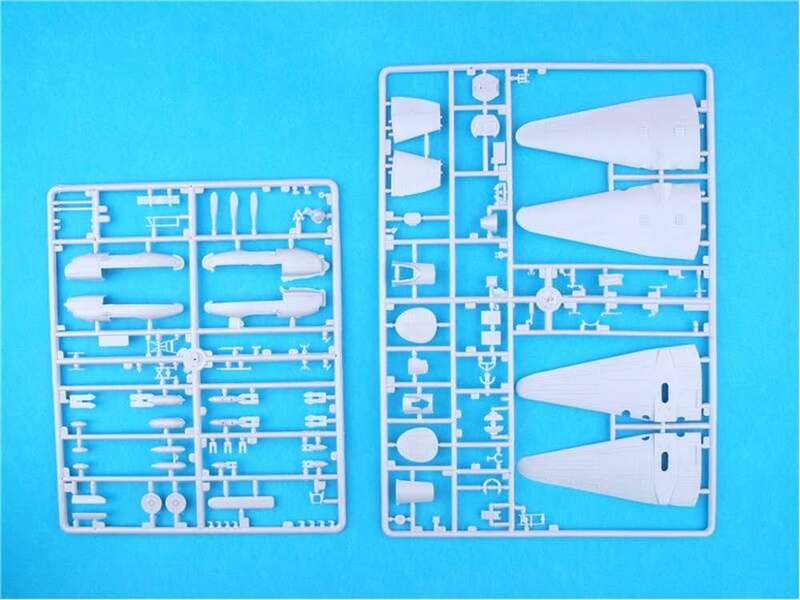 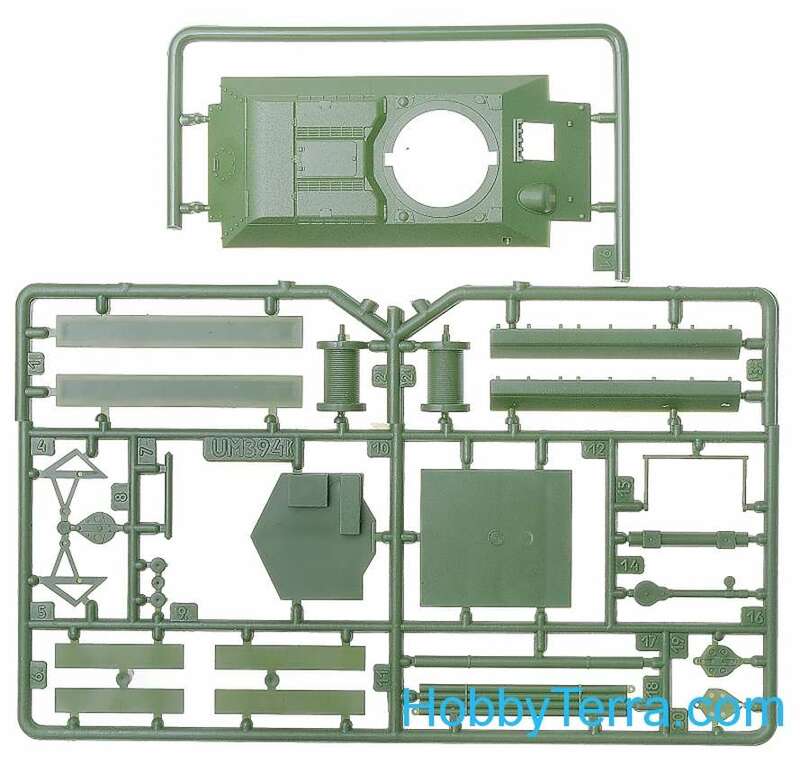 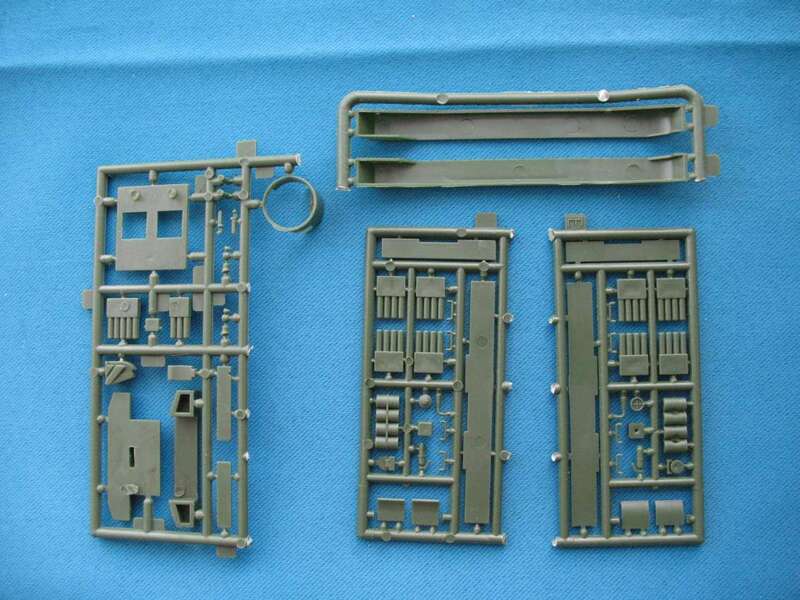 Up to the usual Unimodel (Skif) high standards, this much anticipated kit has six sprues of 109 crisp, clean injection moulded parts (including 'link and length' tracks), a small photo etched fret and a set of decals with markings for two Soviet SU-76s. 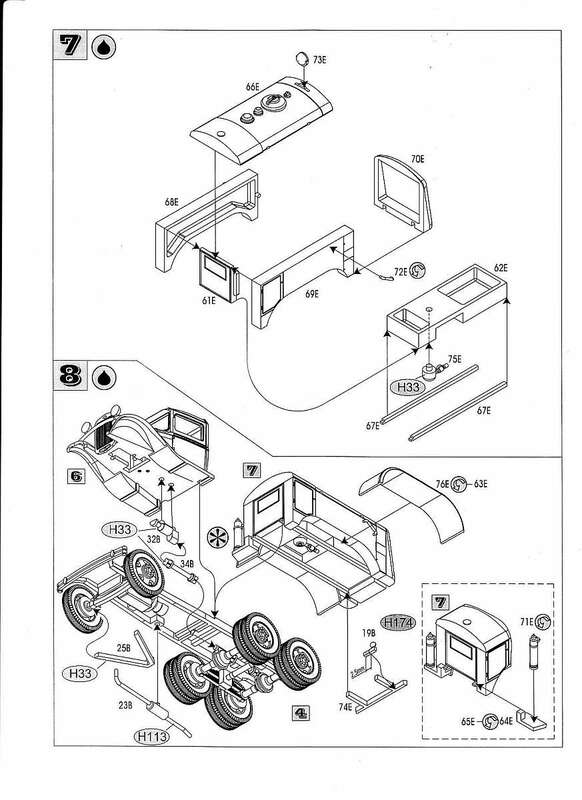 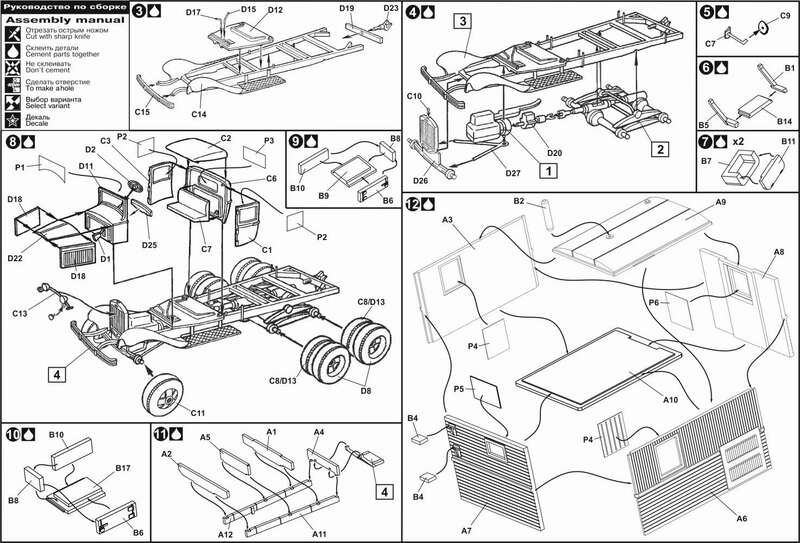 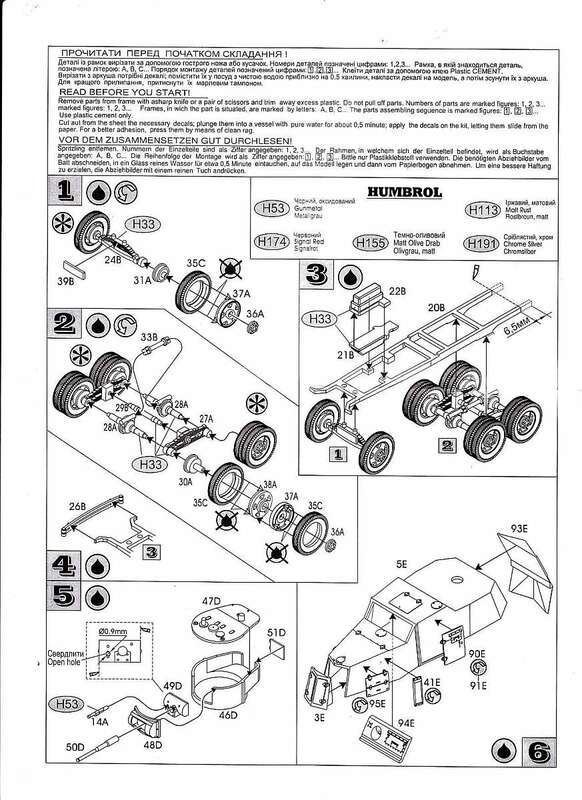 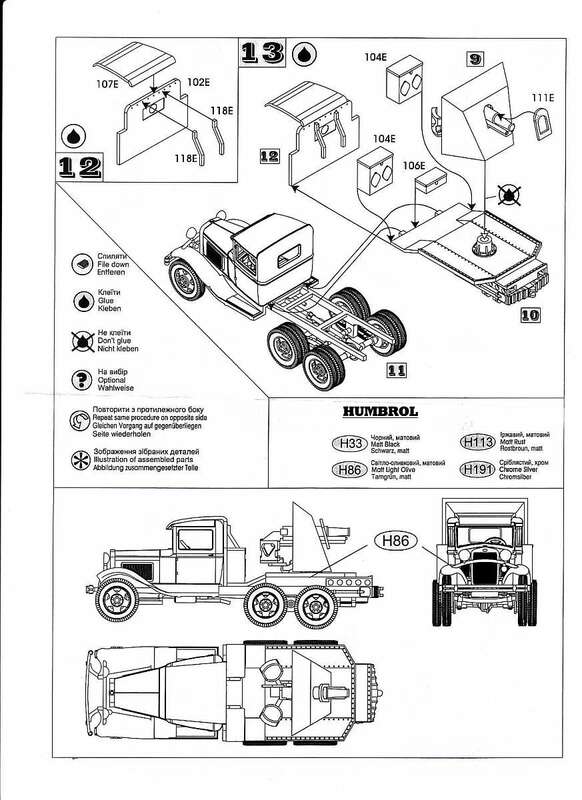 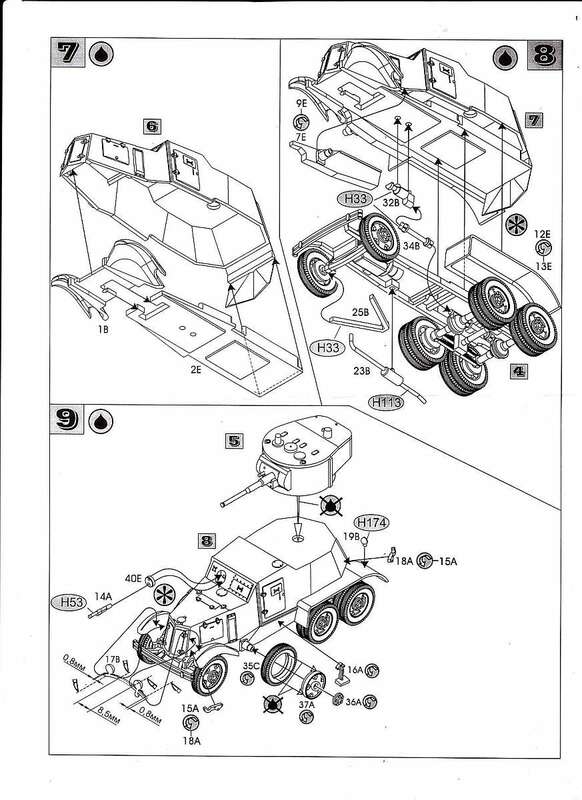 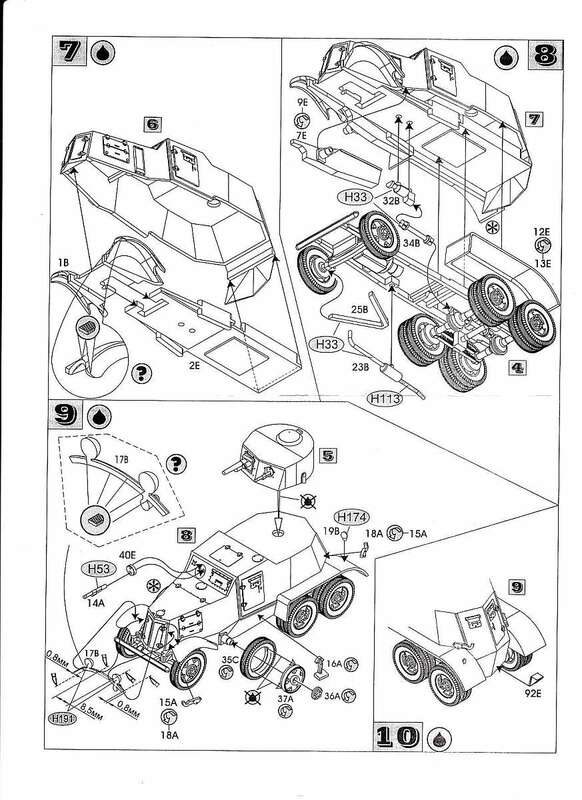 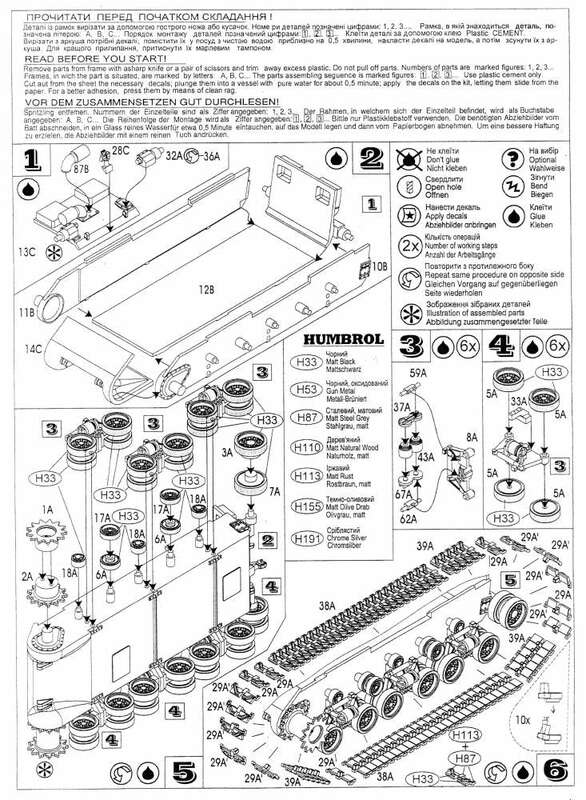 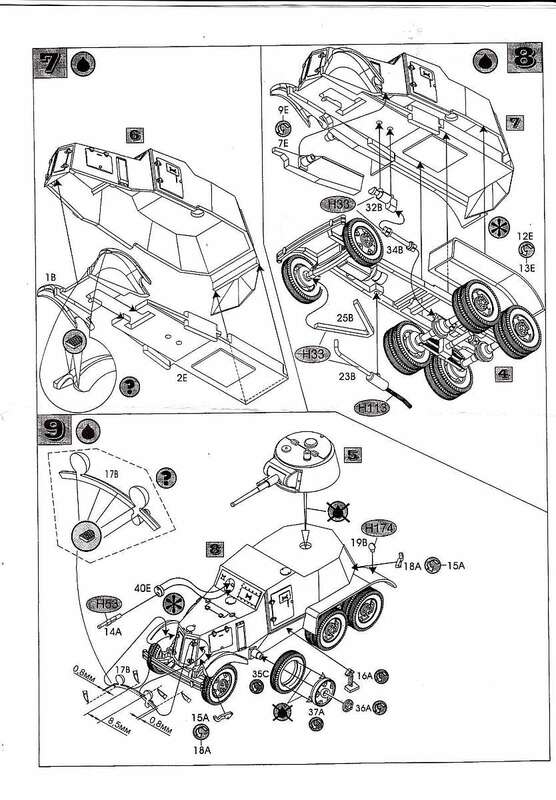 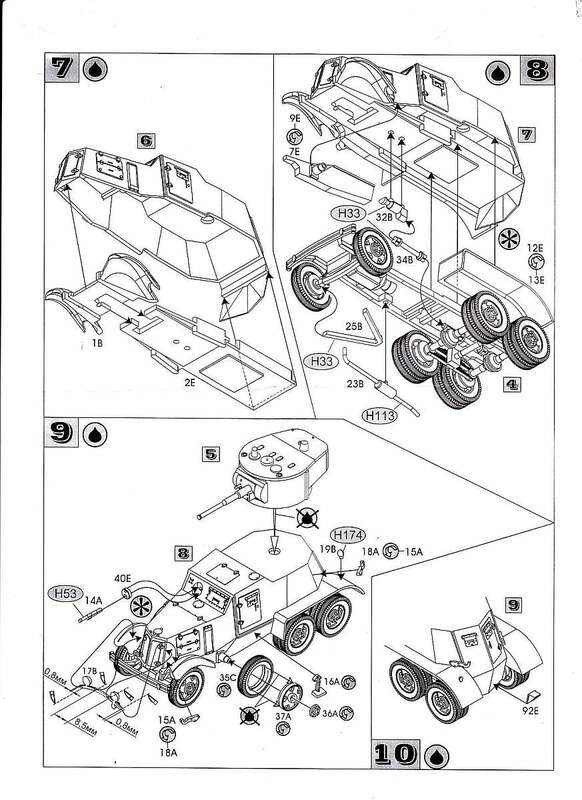 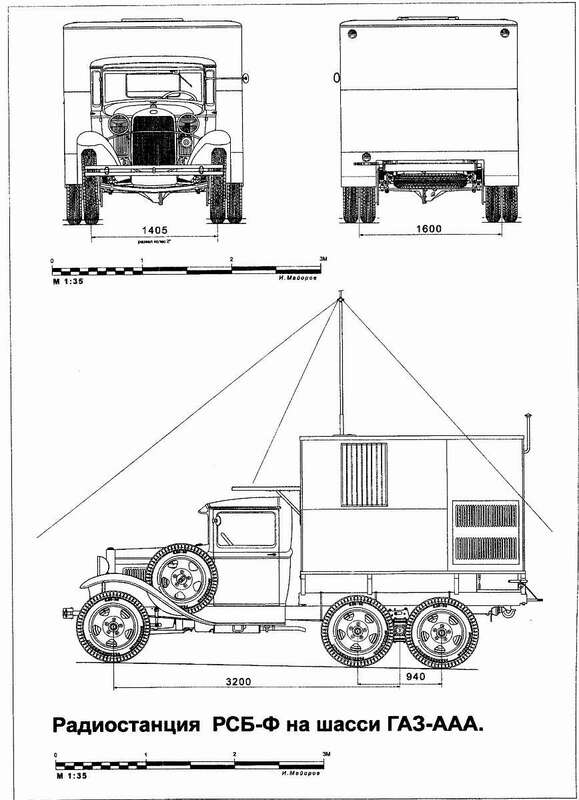 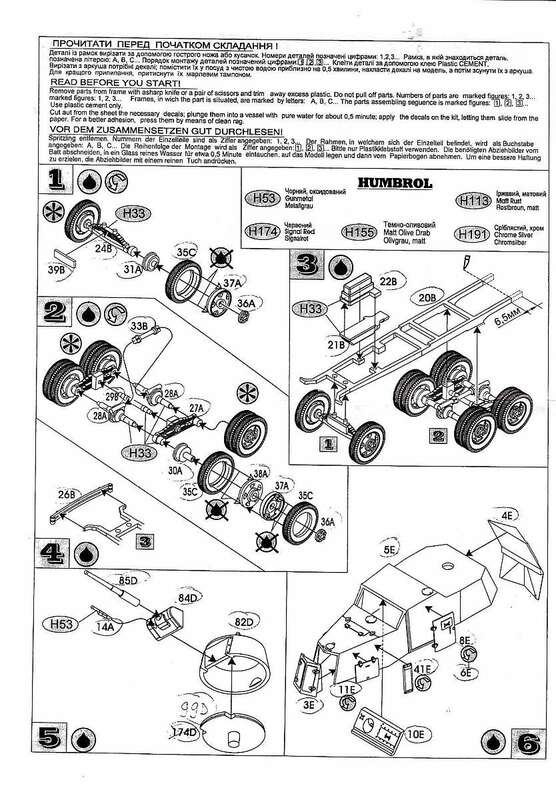 All road wheels and suspension arms are moulded separately, while the four part hull has two optional position hatches (but no interior detail). 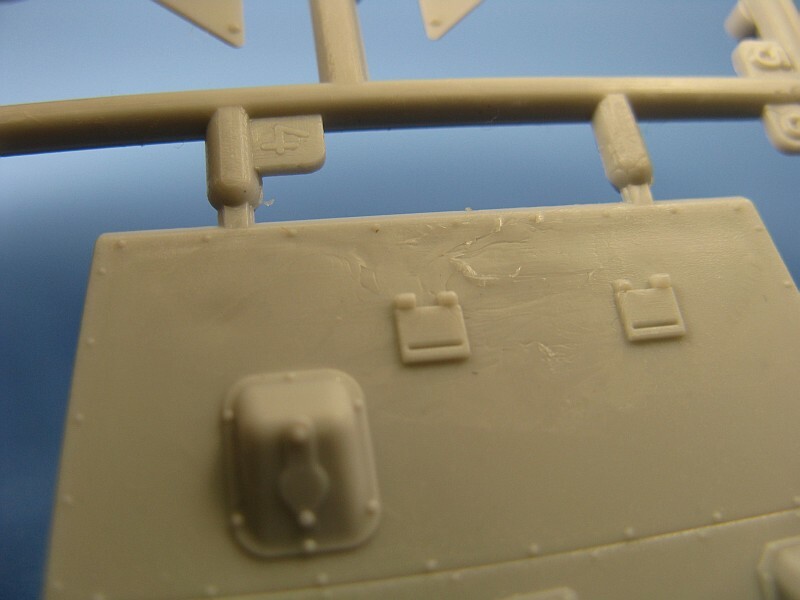 The upper hull is nicely detailed and a number of accessories are supplied, including tool boxes, a spot light and tow hook. 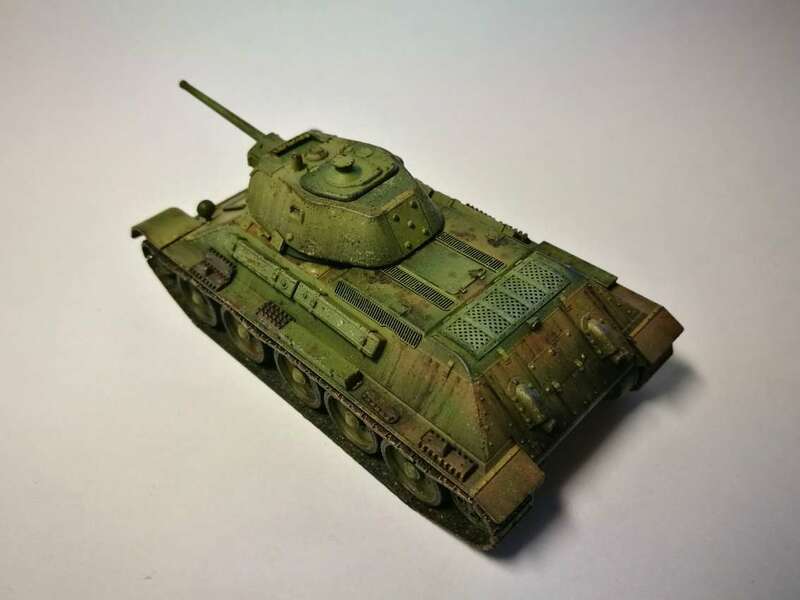 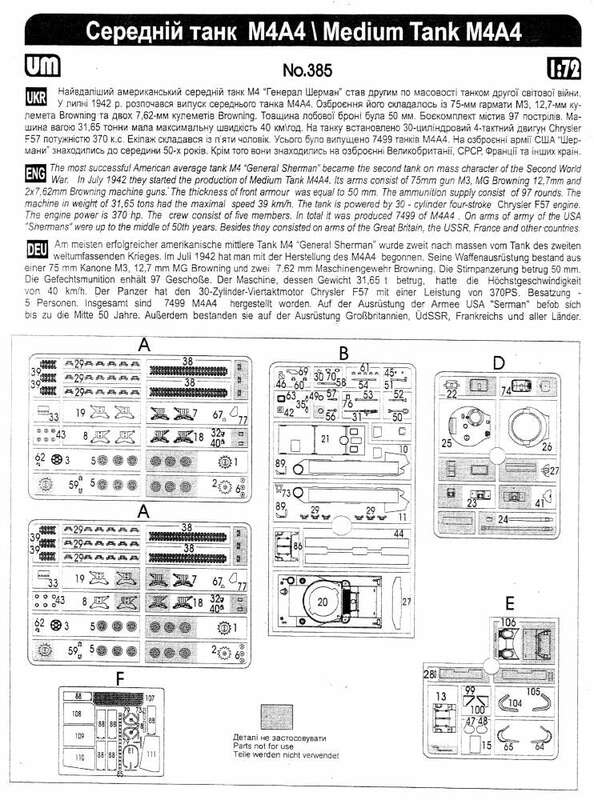 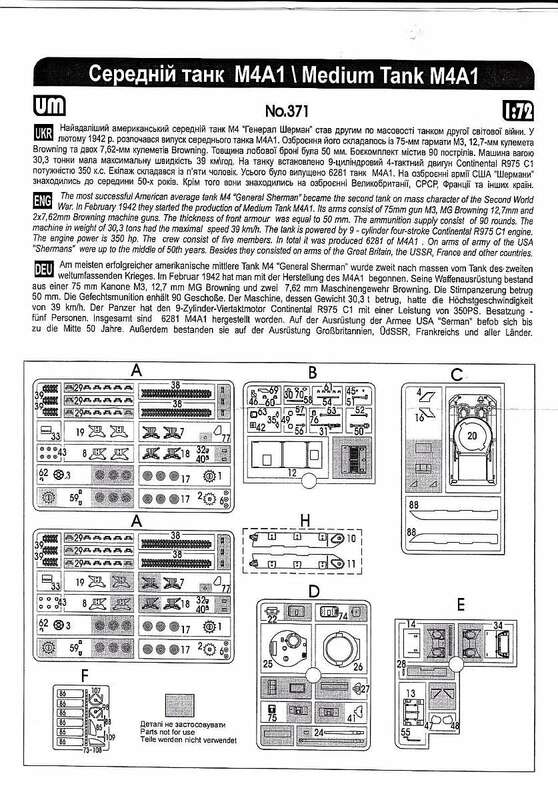 This is the second release from the Skif/IBG 'Unimodel' partnership and it looks just as good as the first (the BT-5). 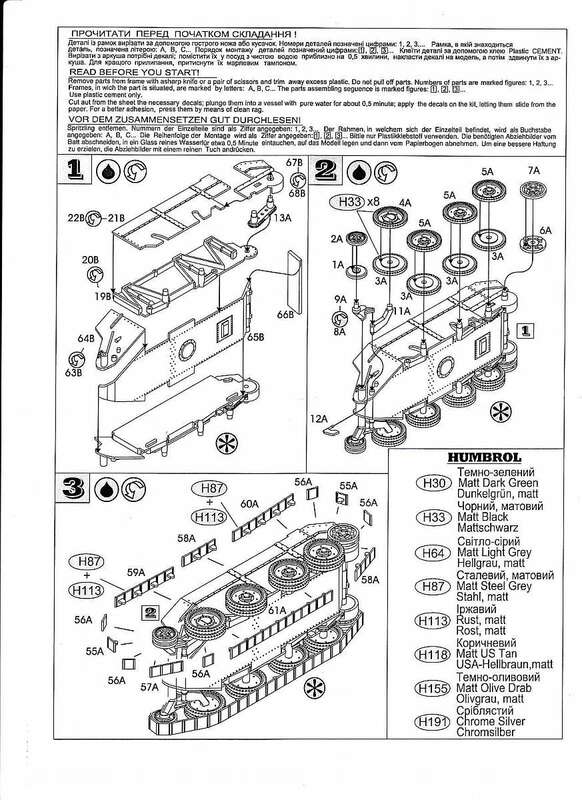 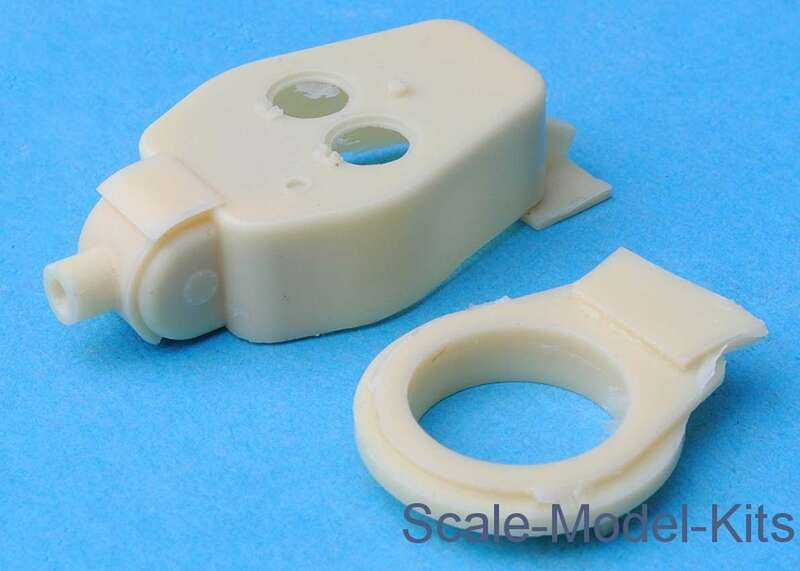 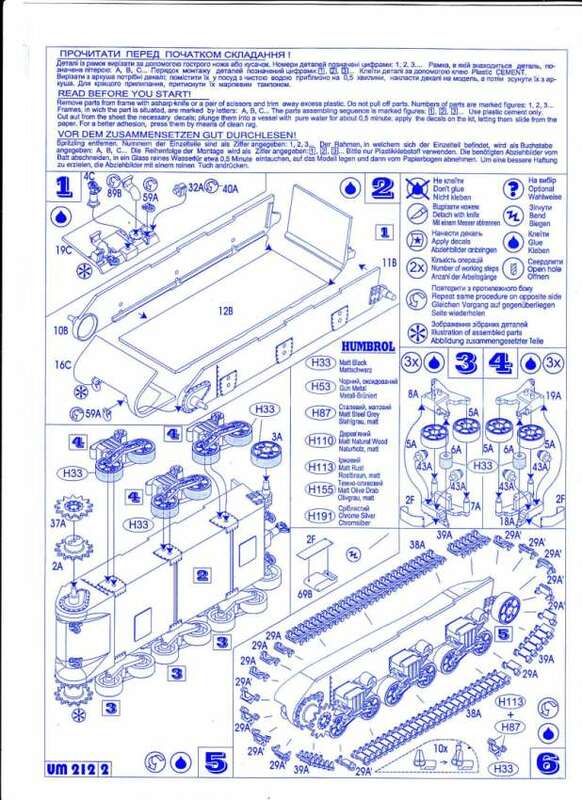 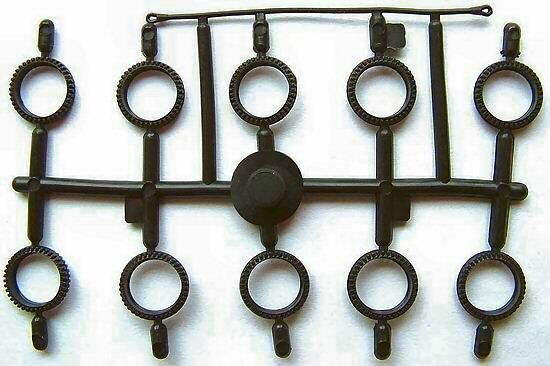 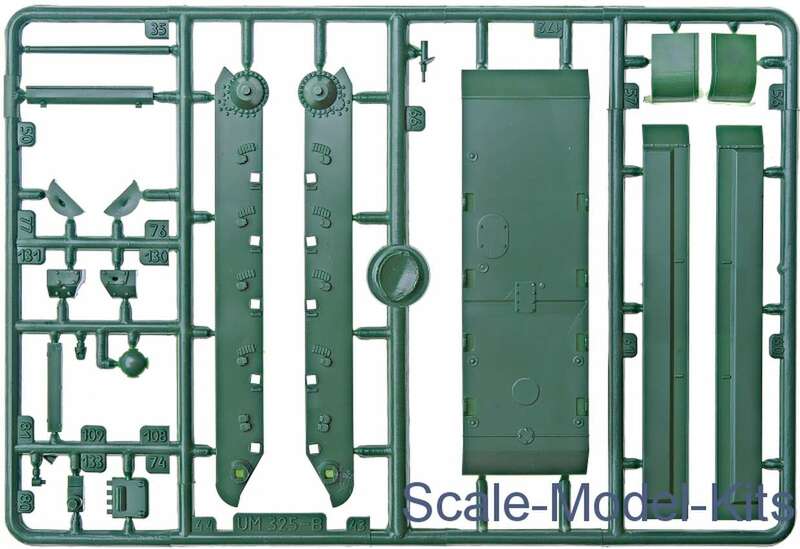 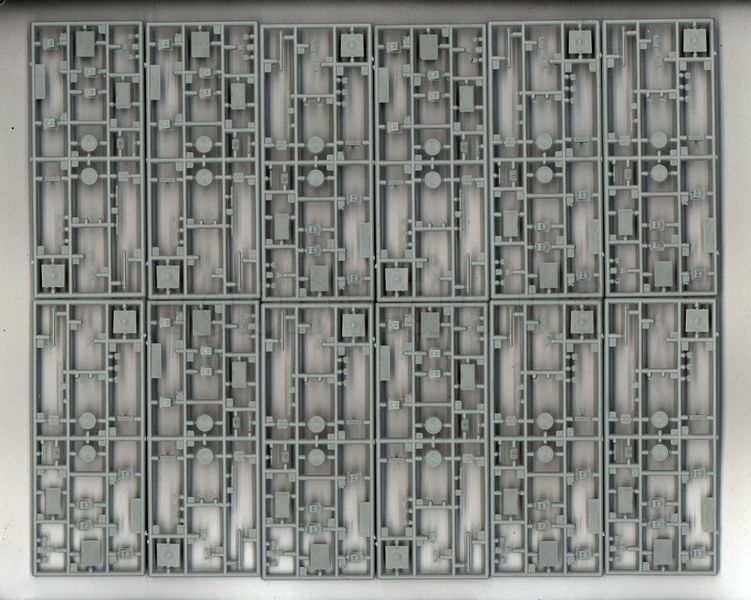 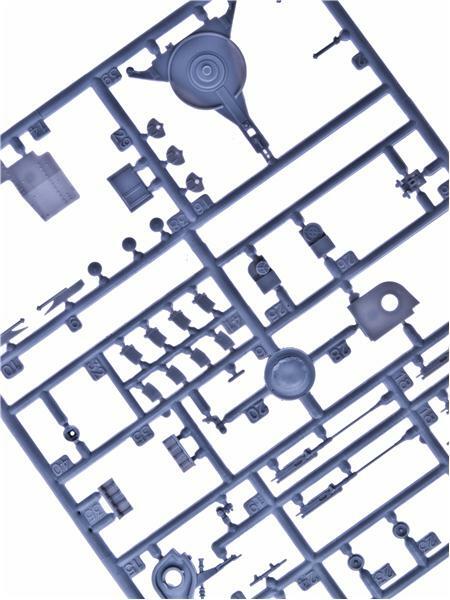 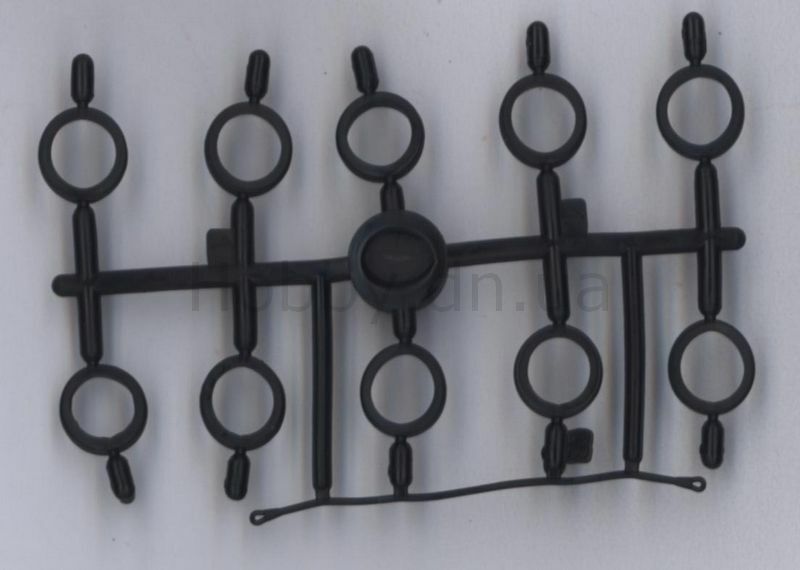 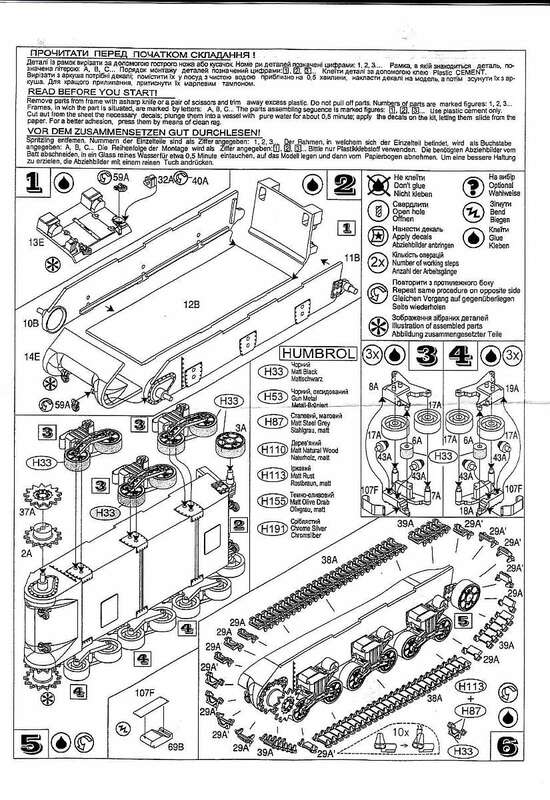 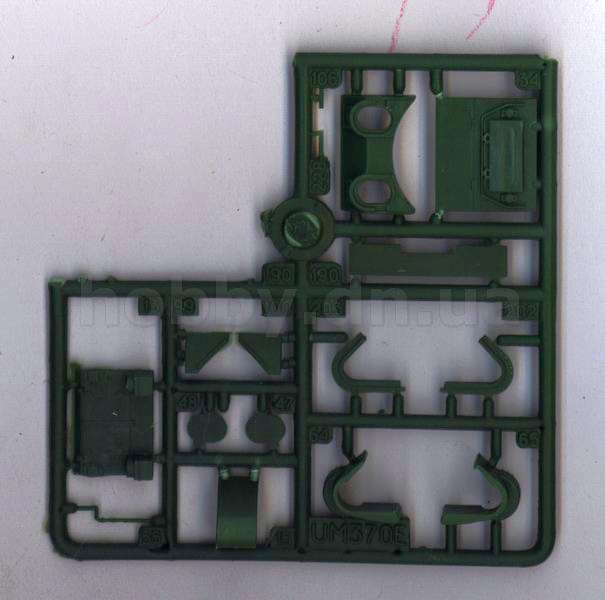 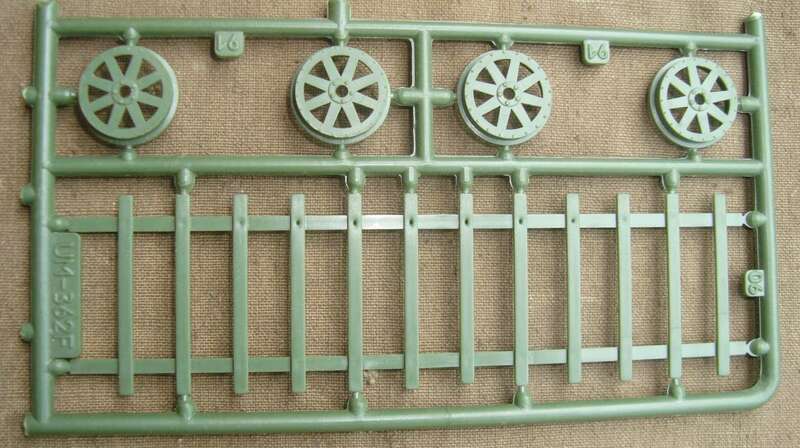 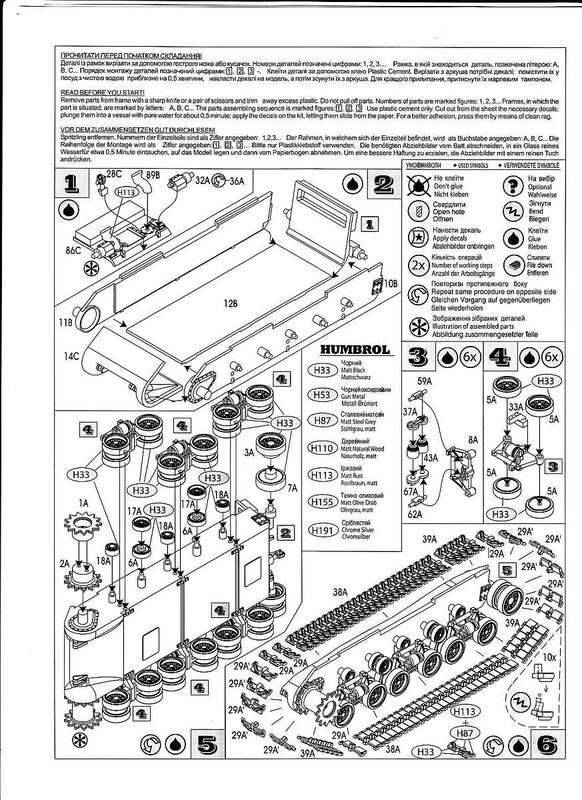 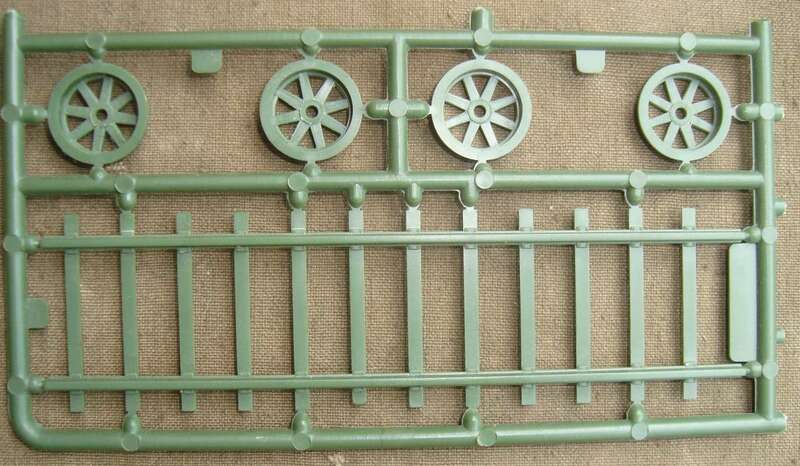 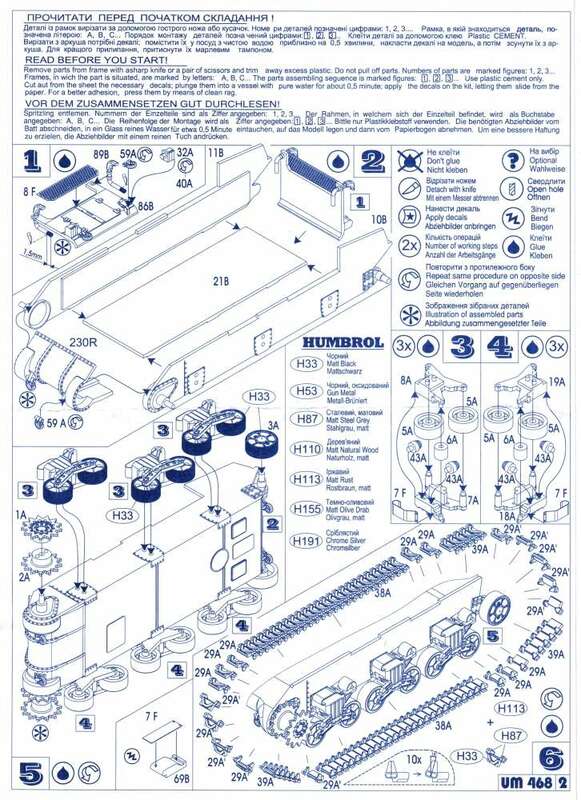 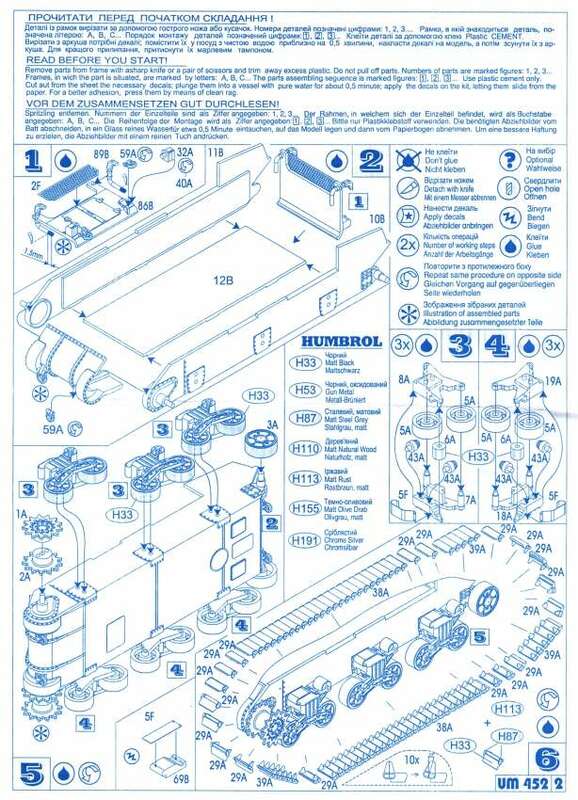 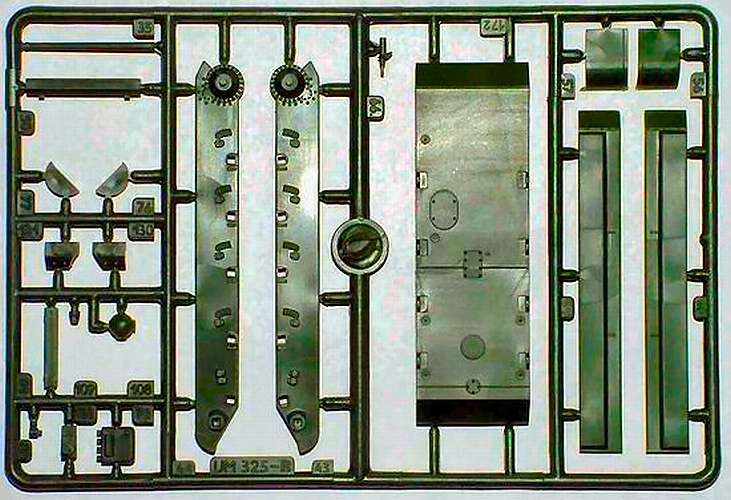 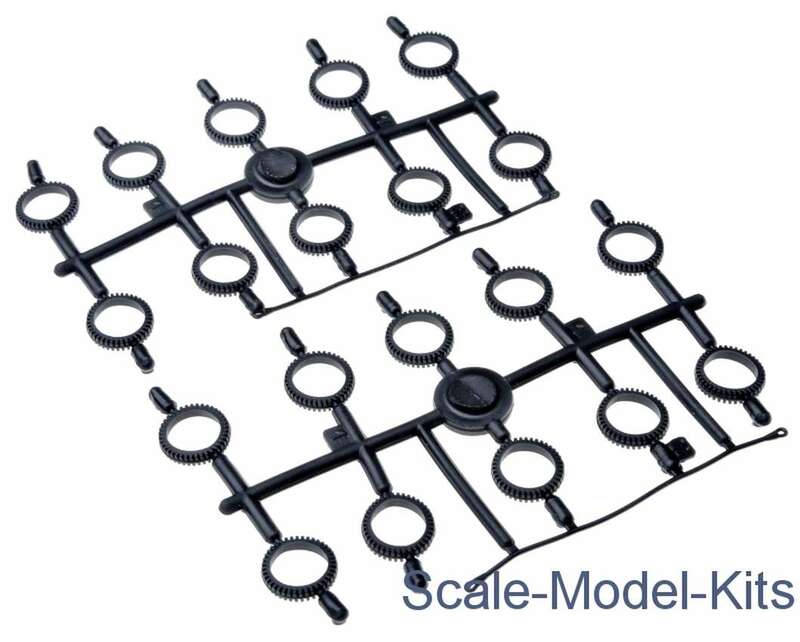 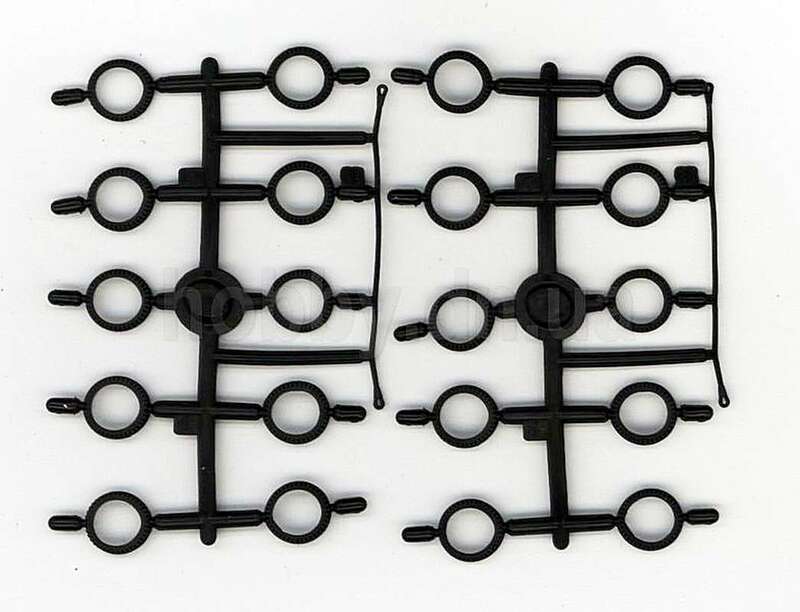 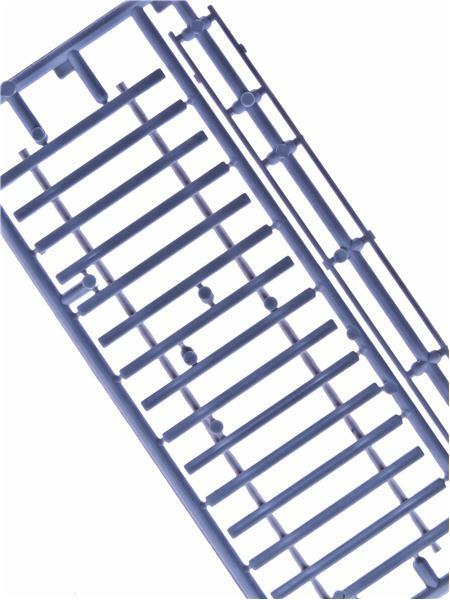 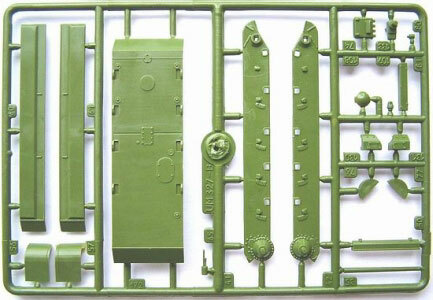 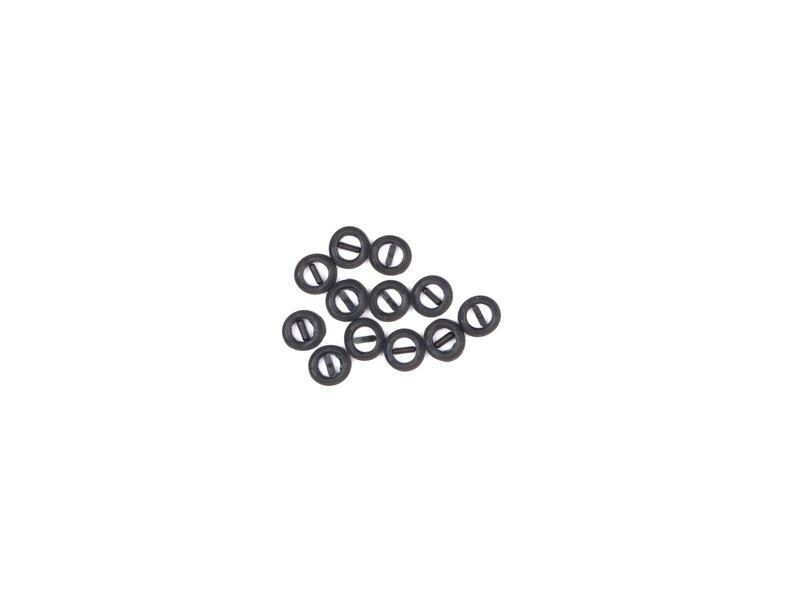 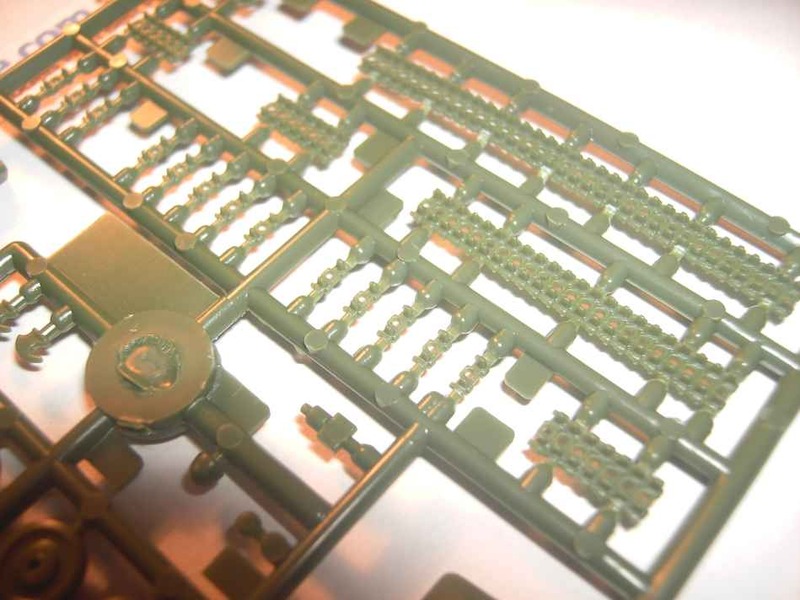 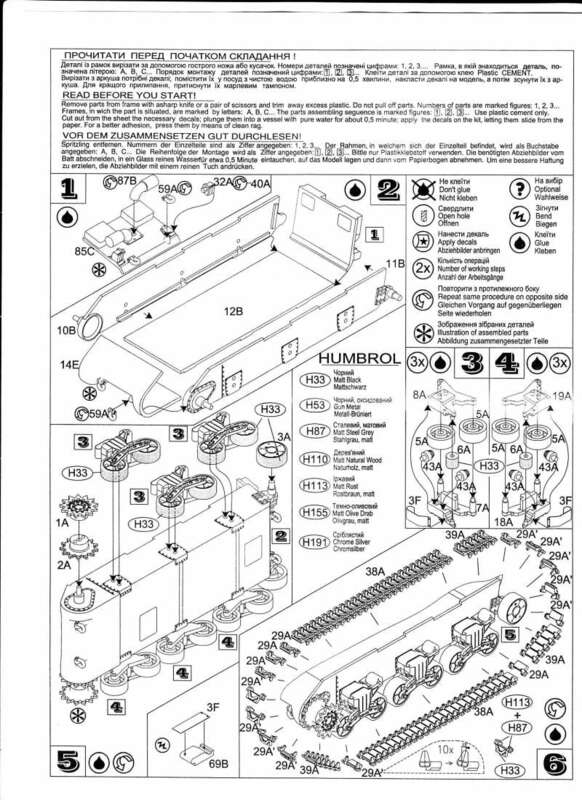 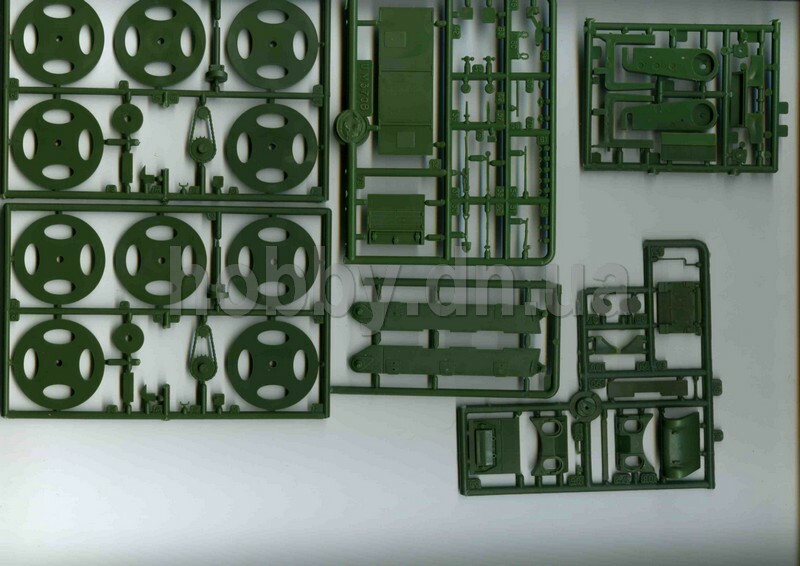 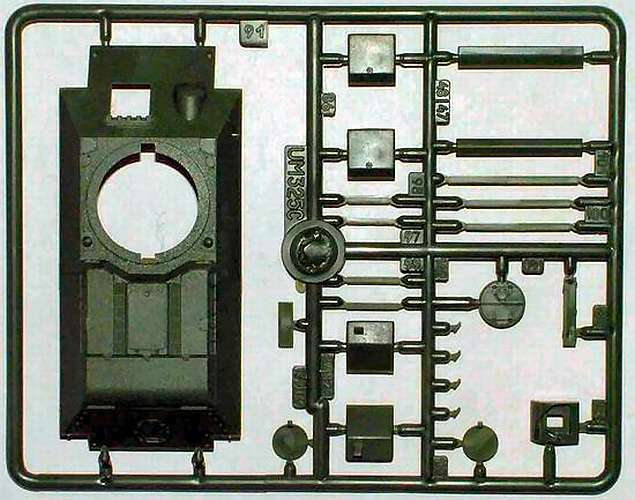 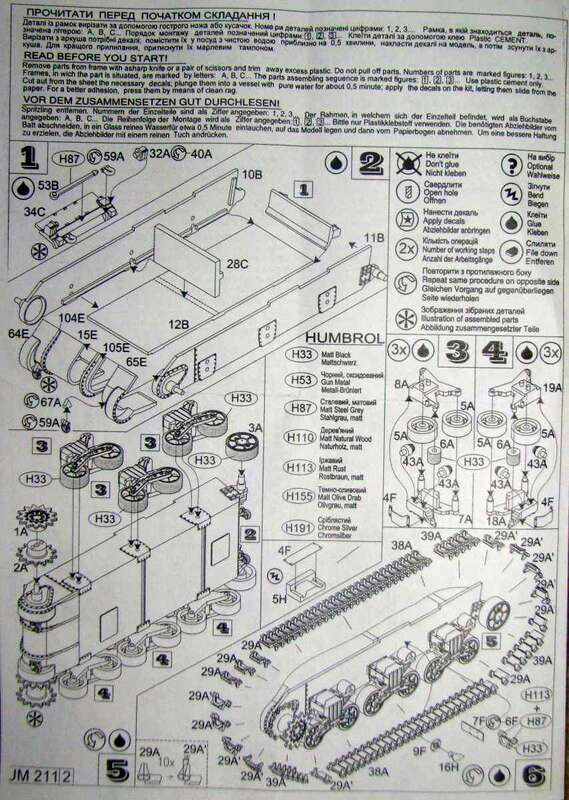 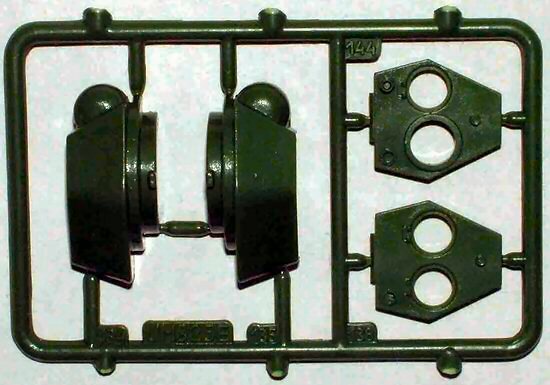 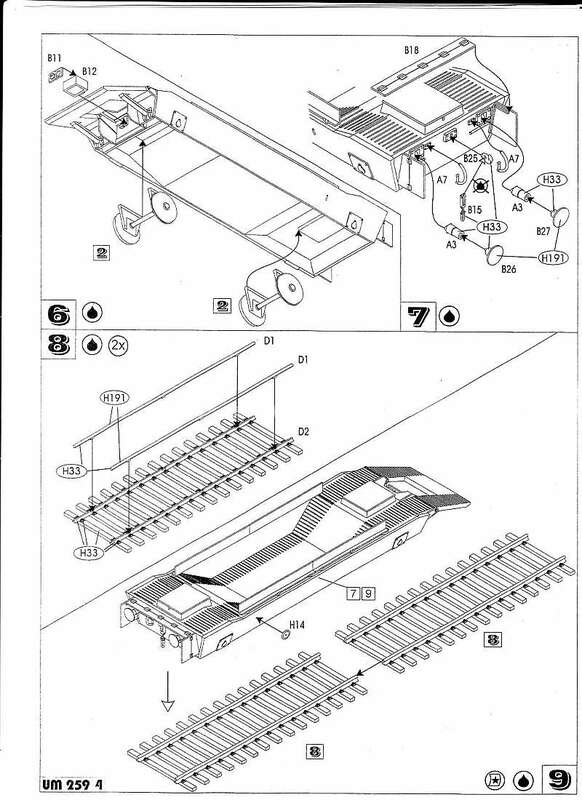 There are 107 'long run' injection moulded parts (including 'link and length' tracks) with fine raised detail. 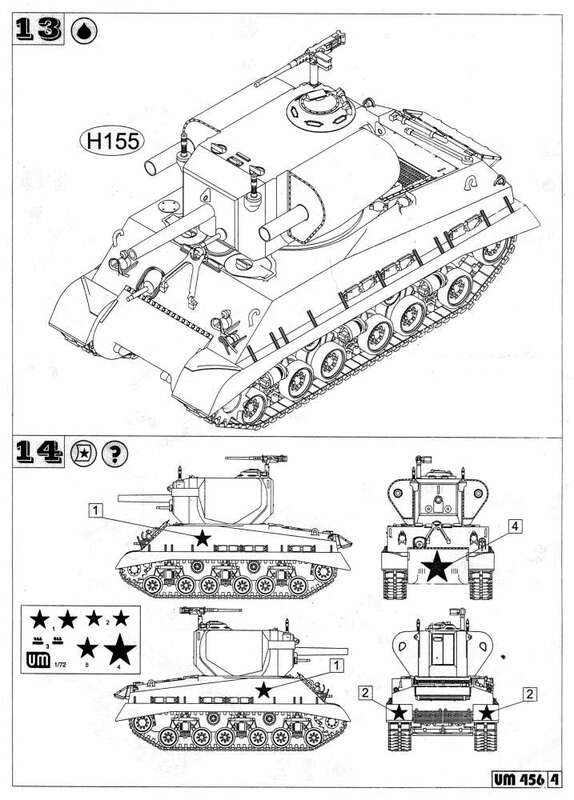 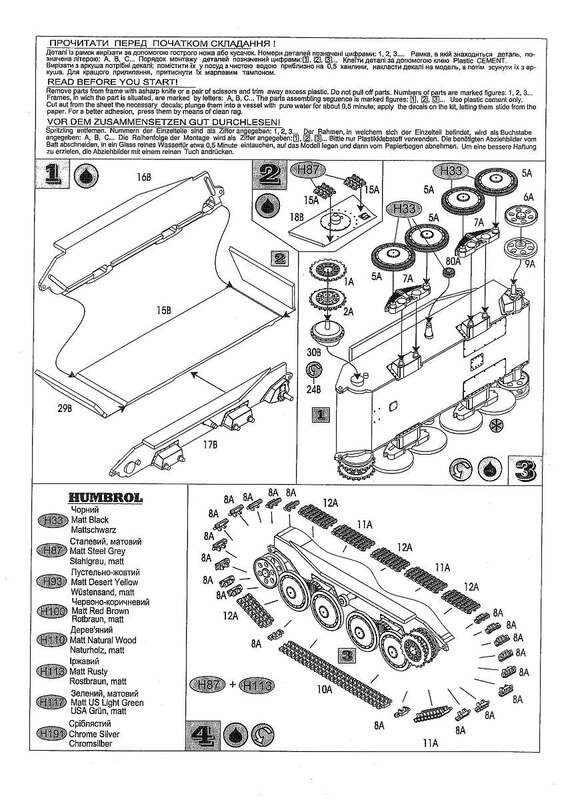 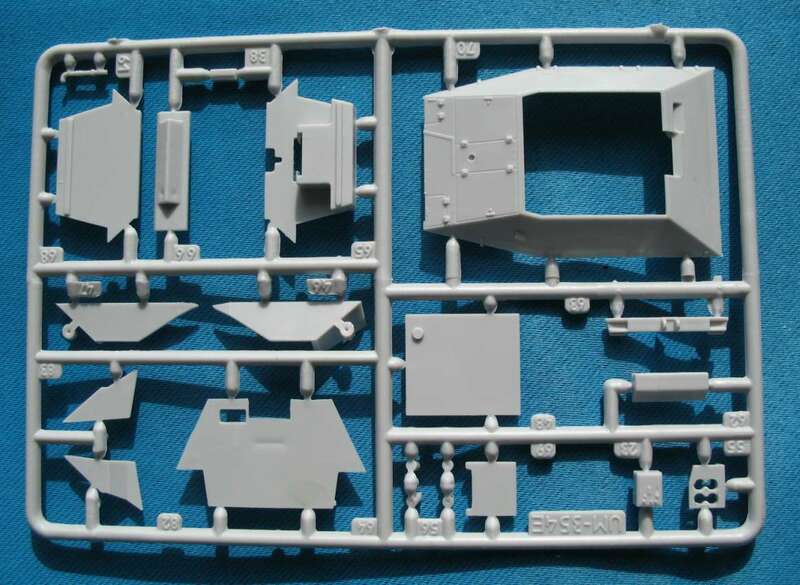 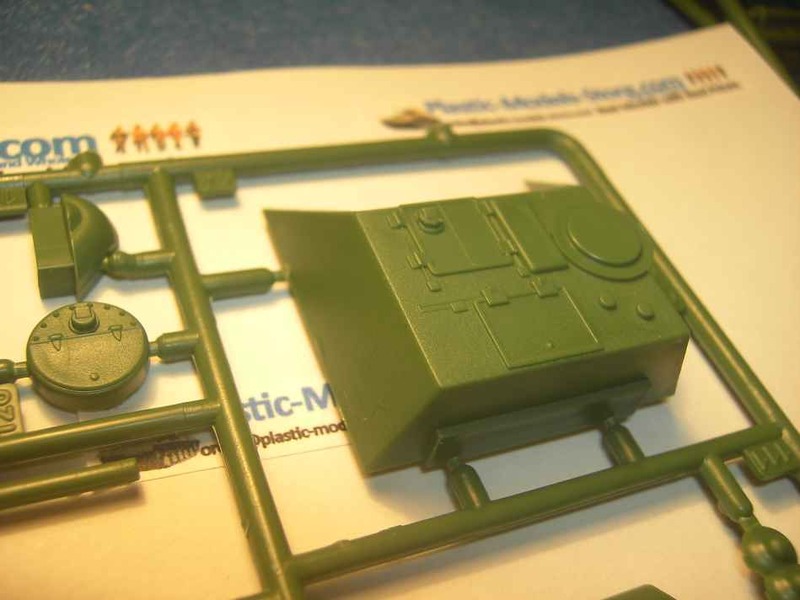 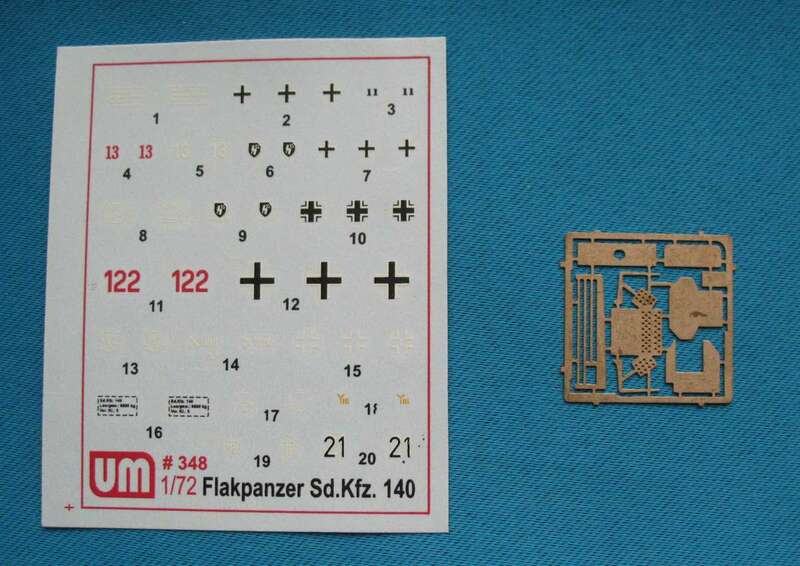 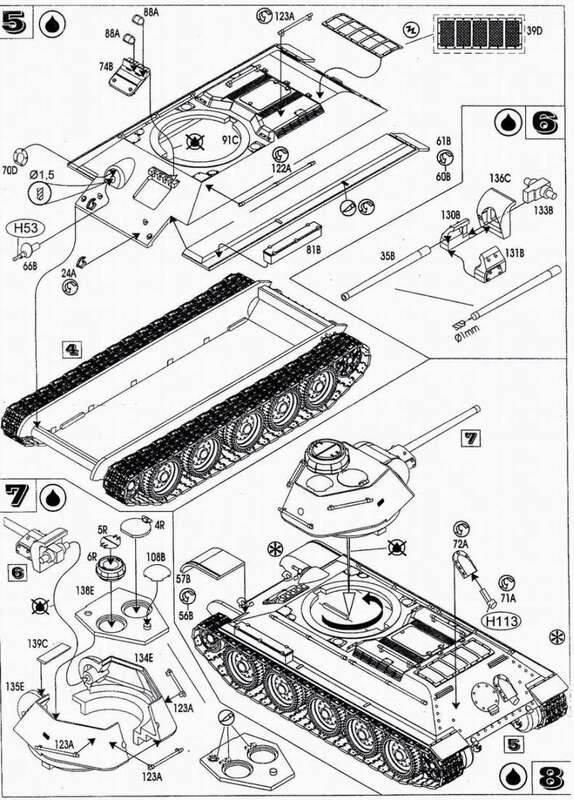 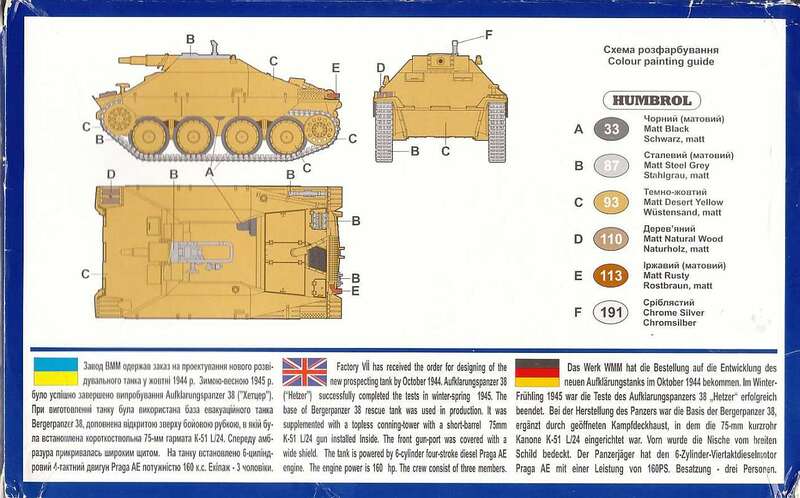 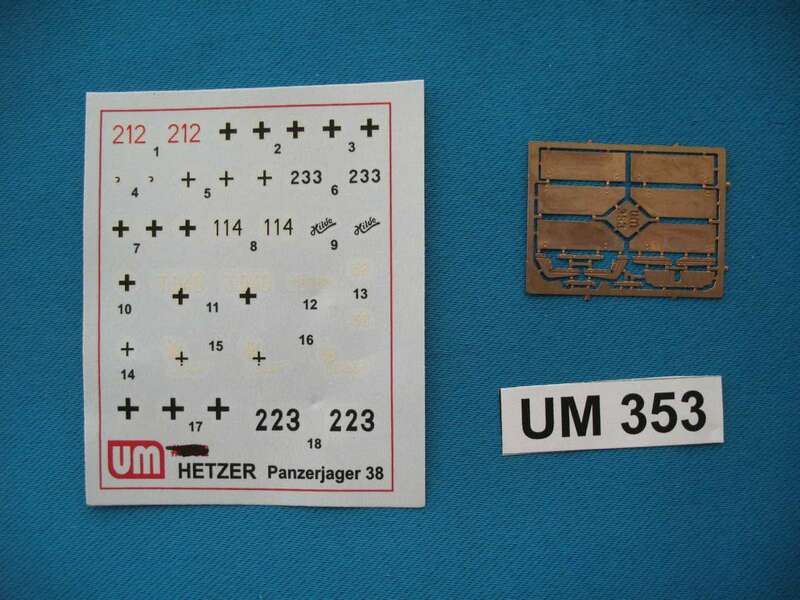 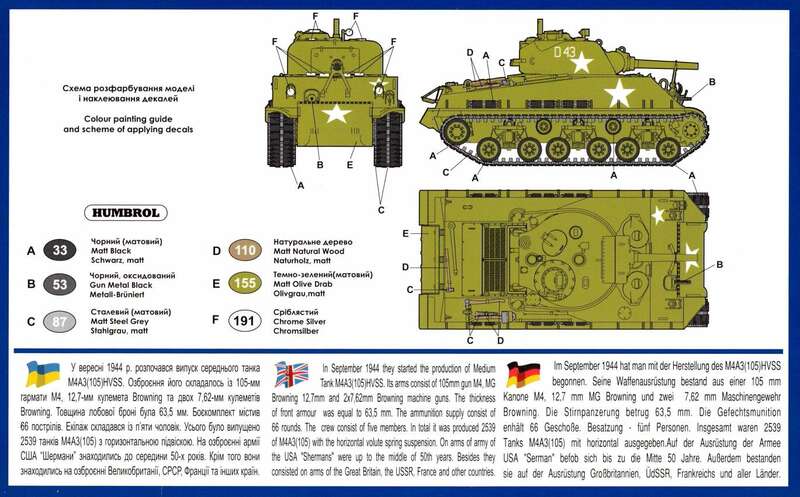 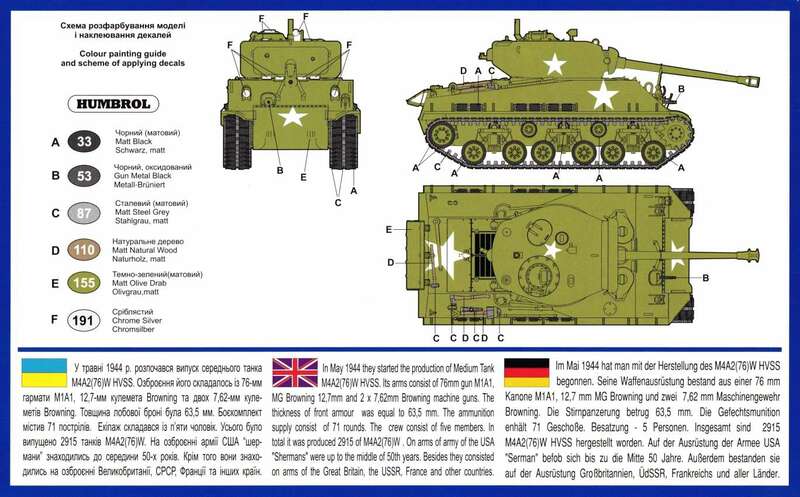 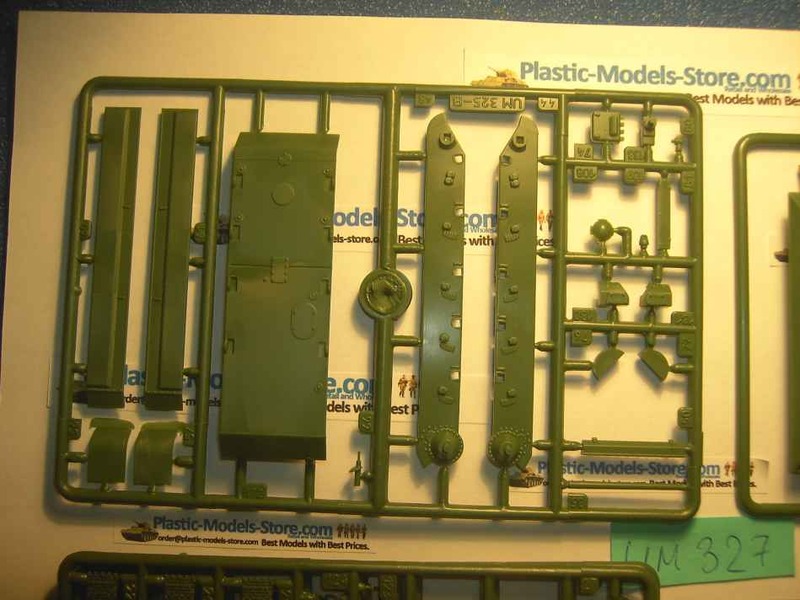 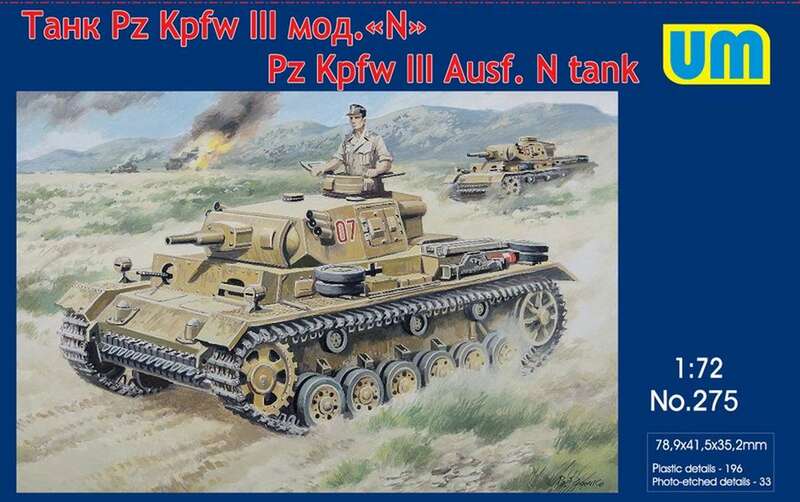 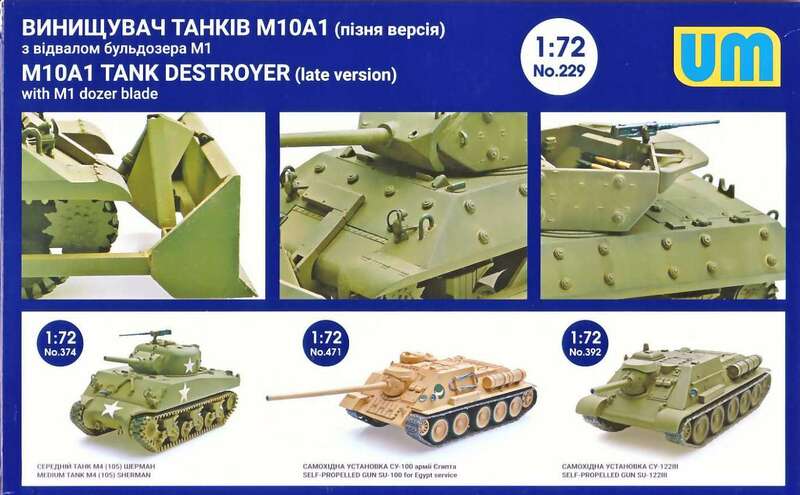 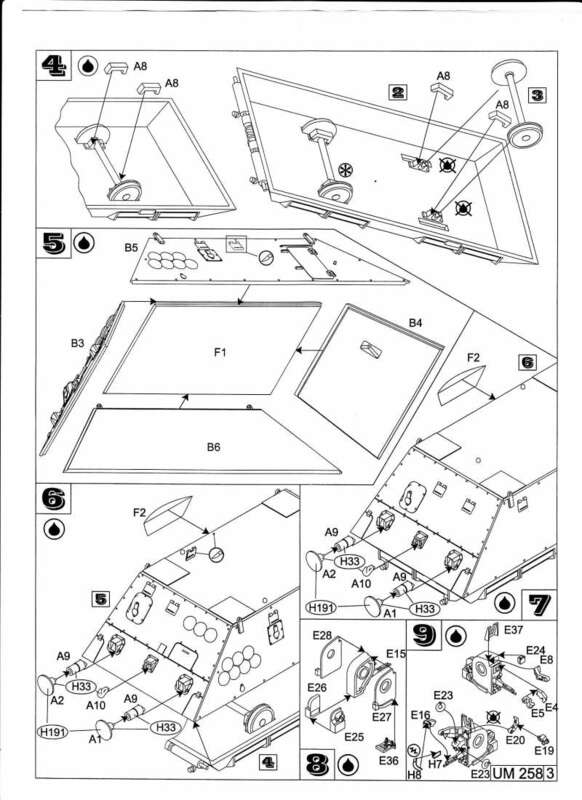 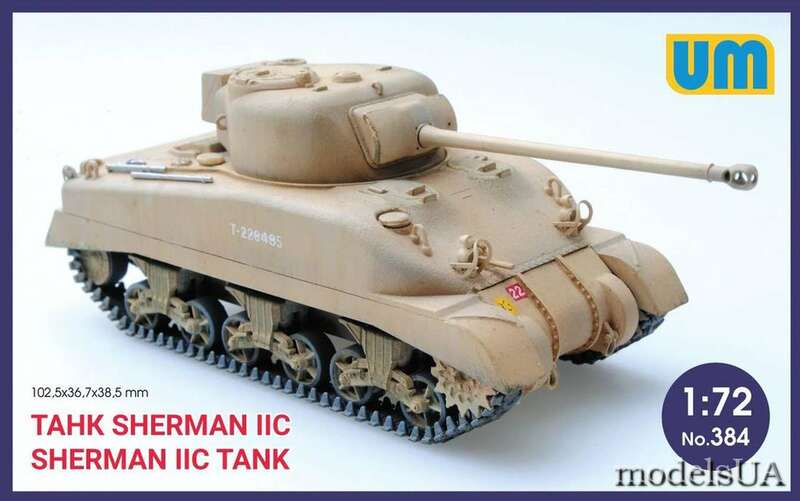 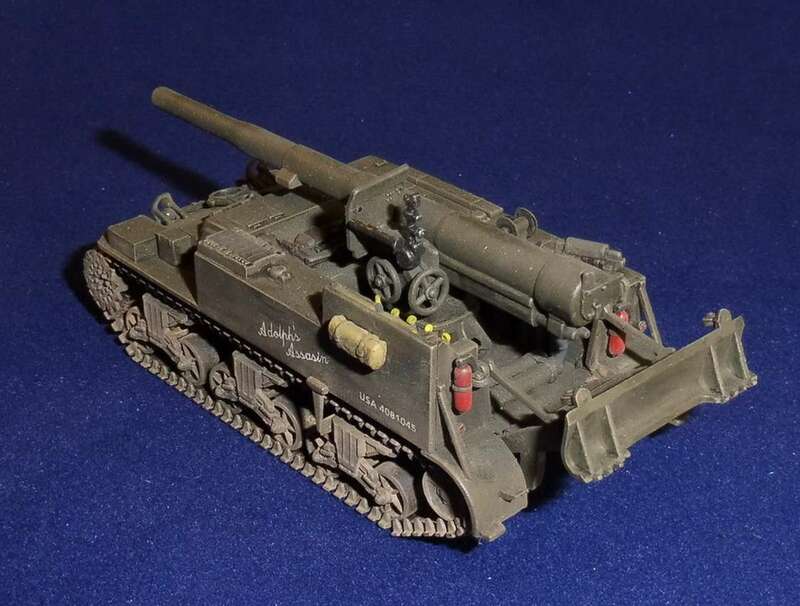 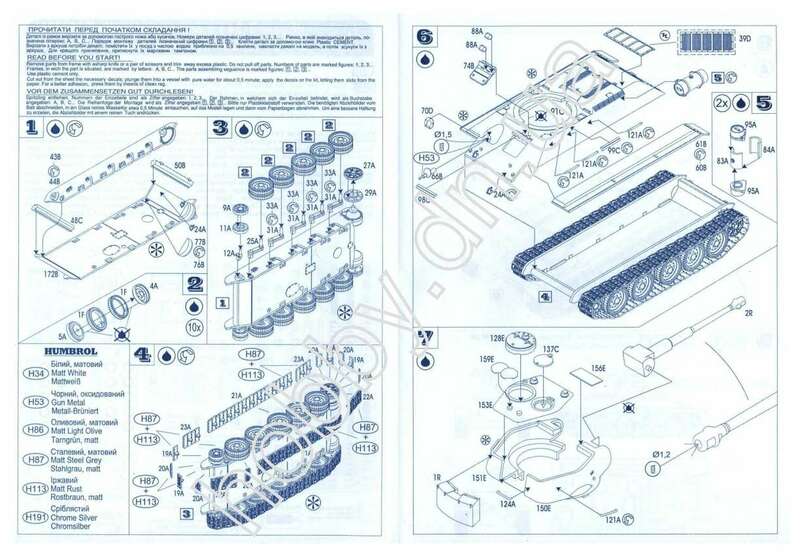 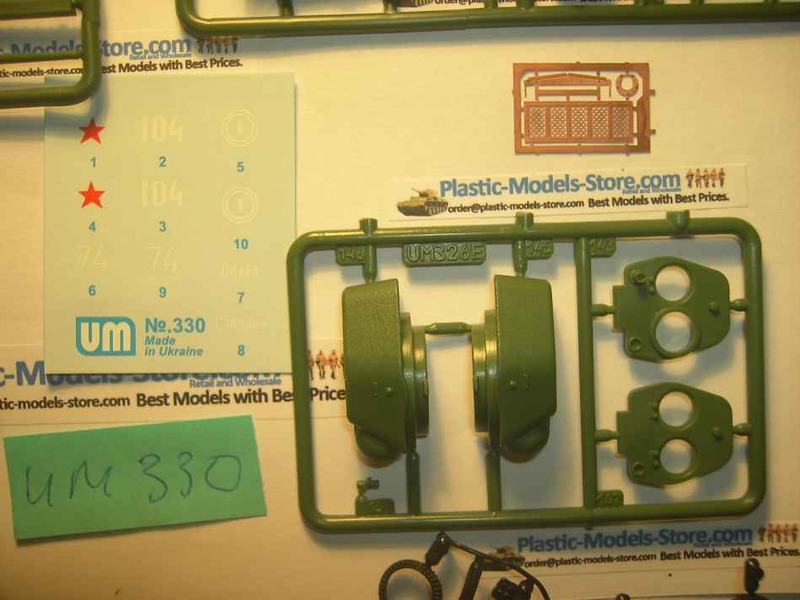 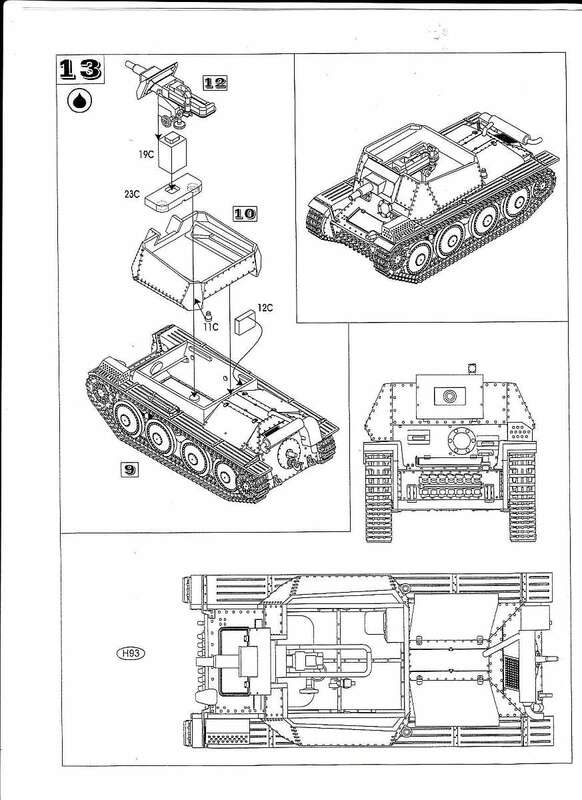 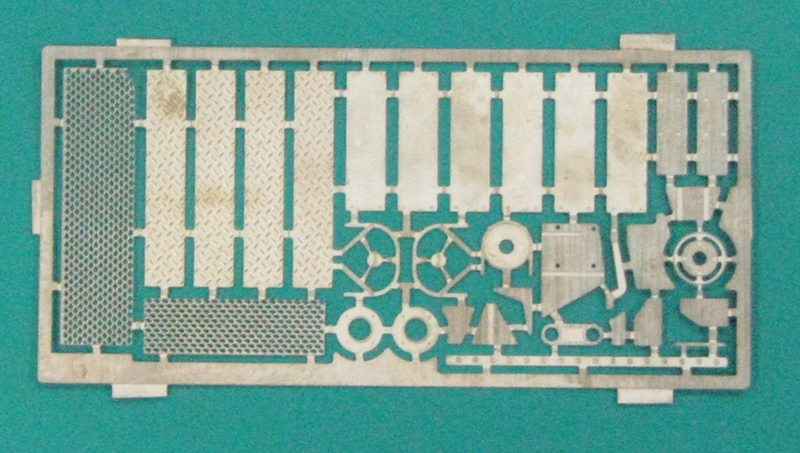 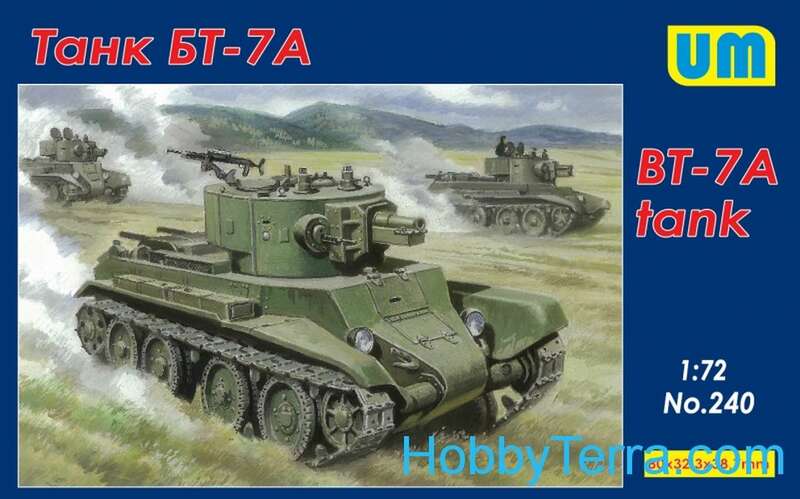 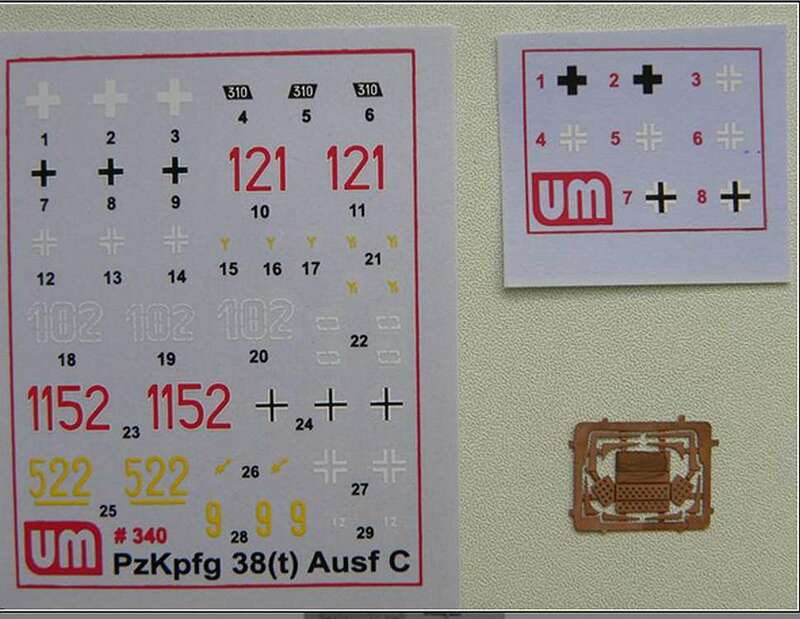 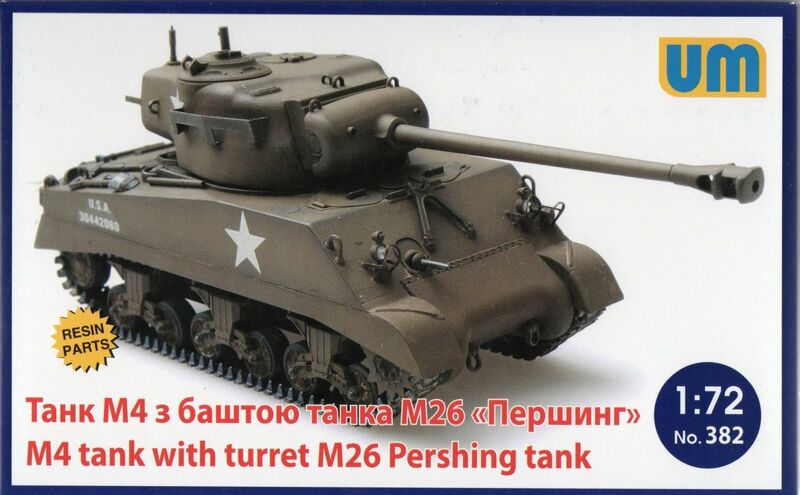 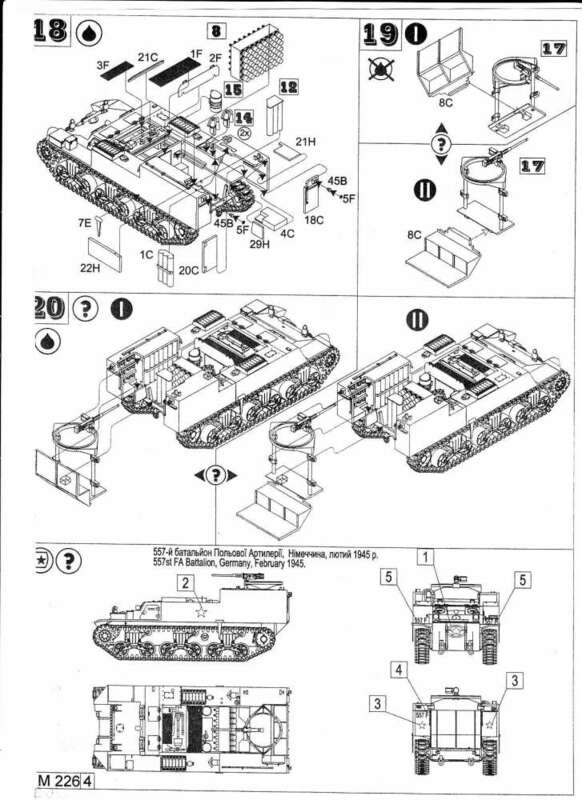 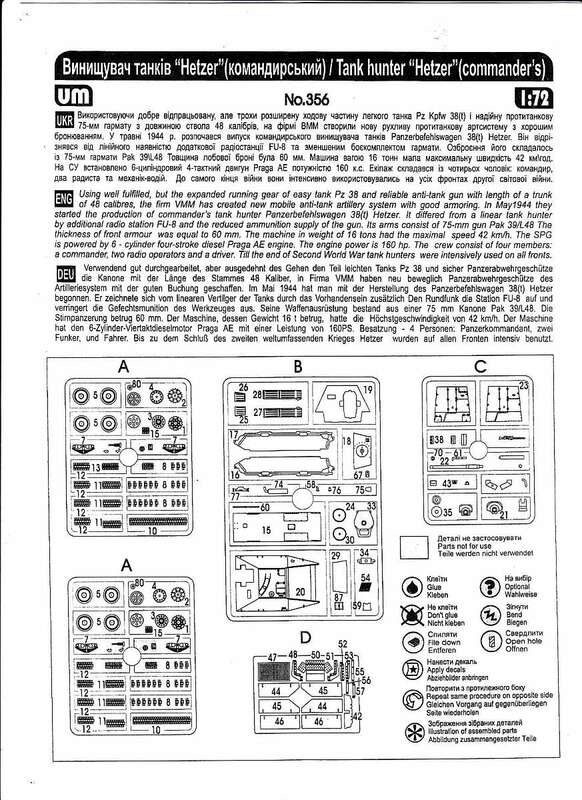 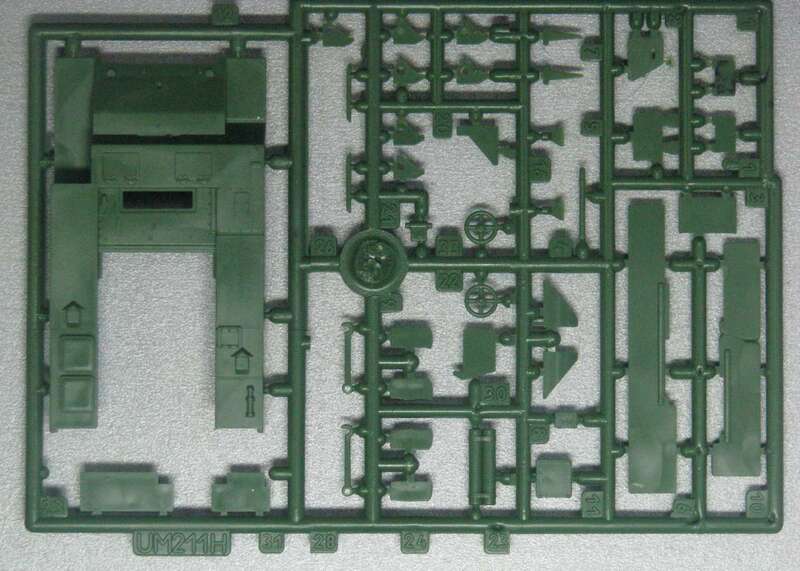 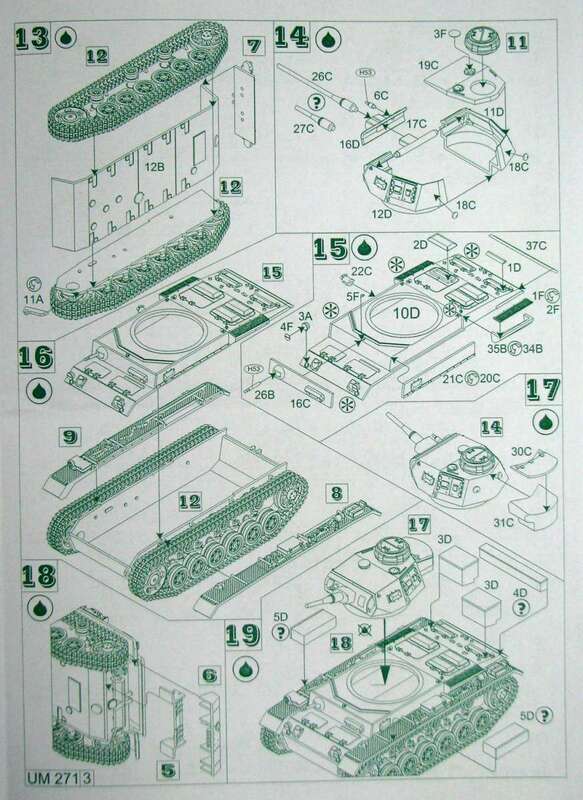 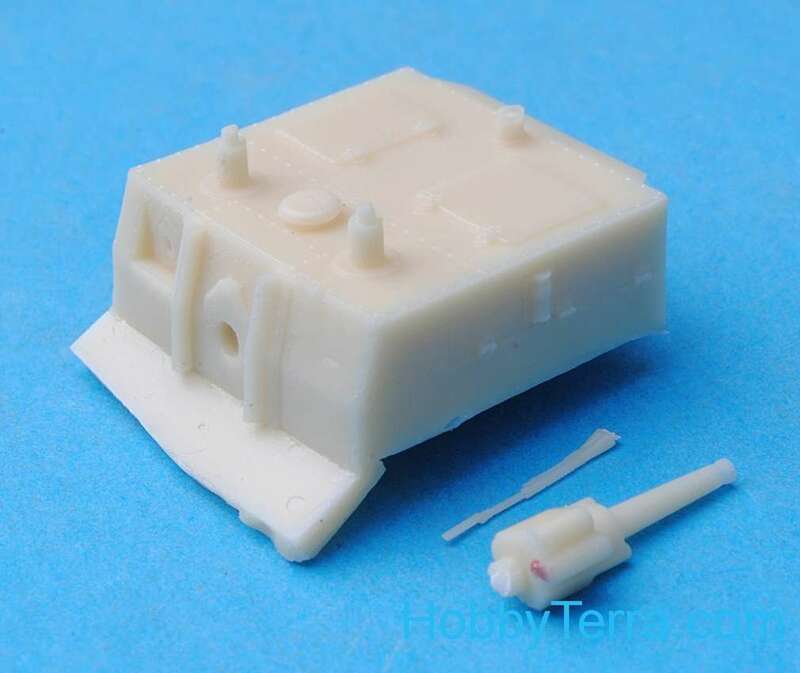 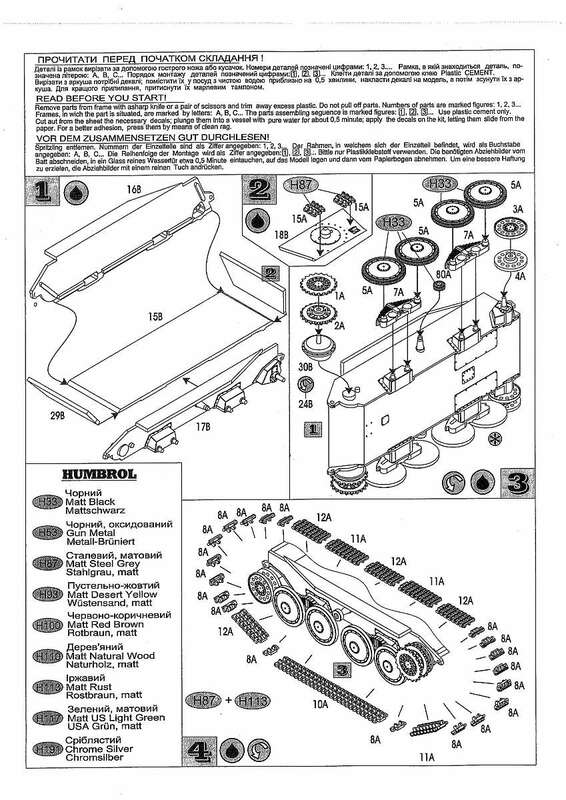 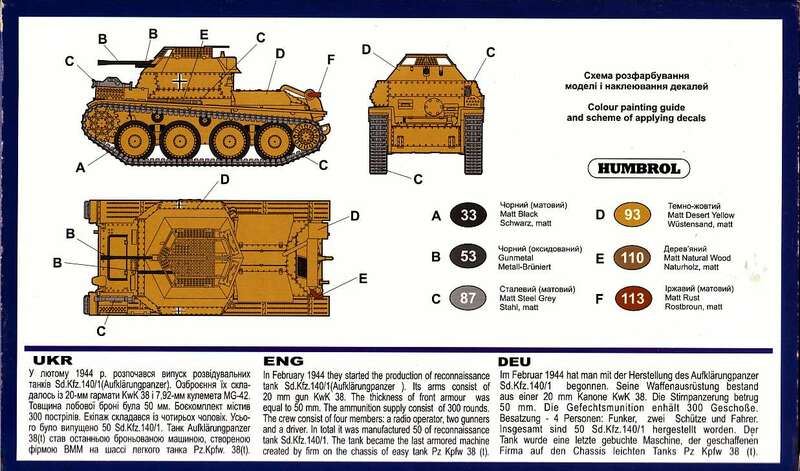 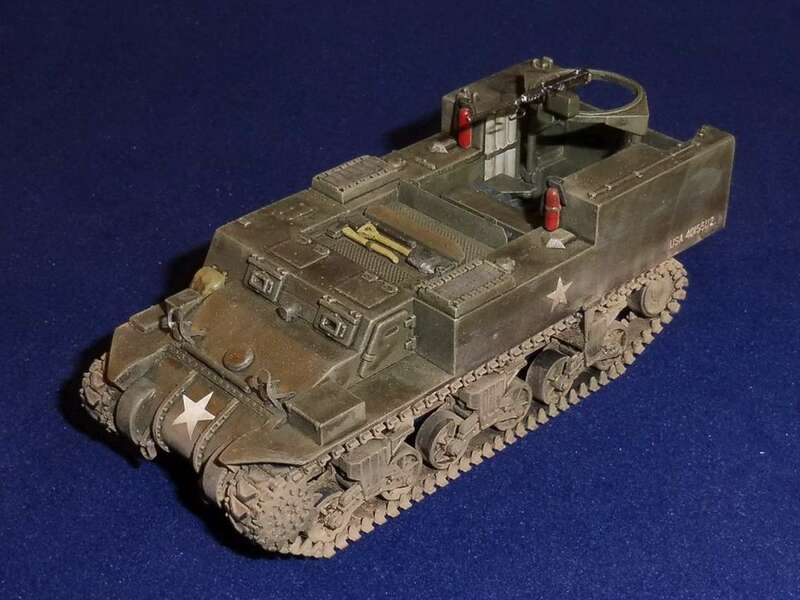 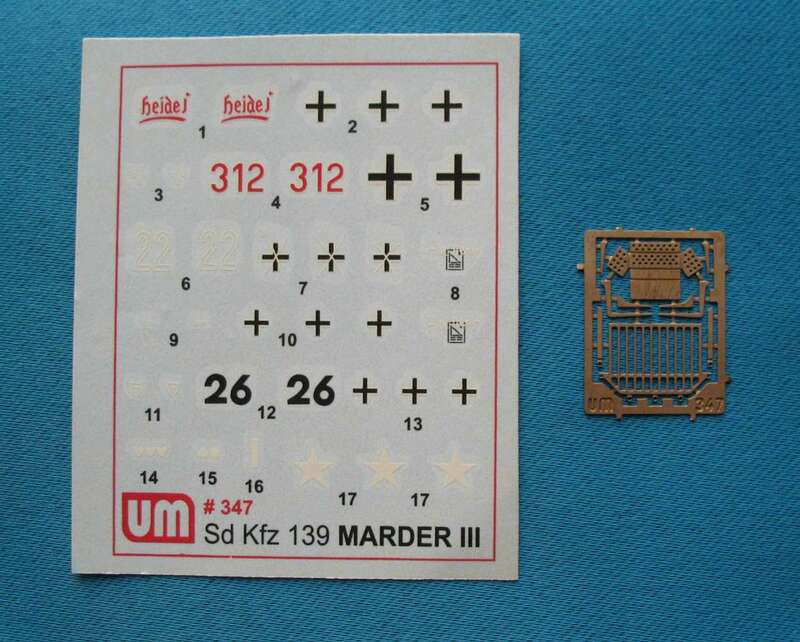 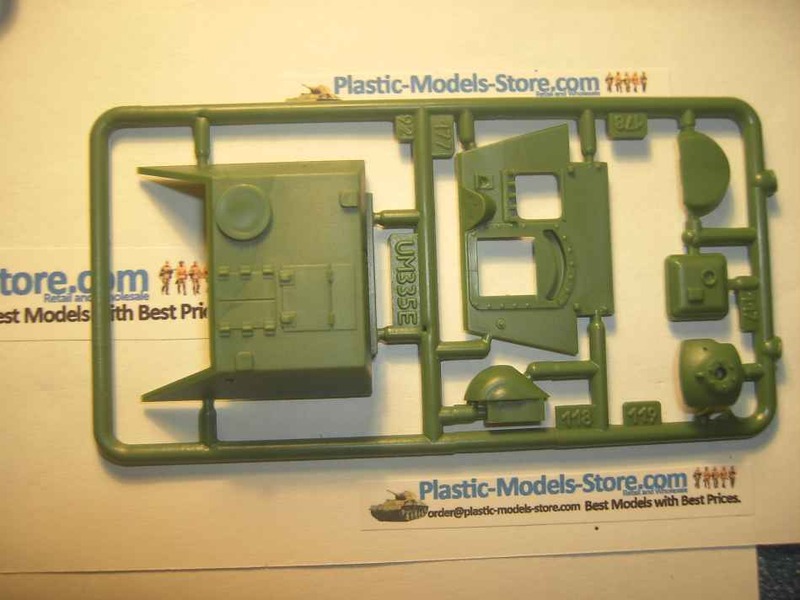 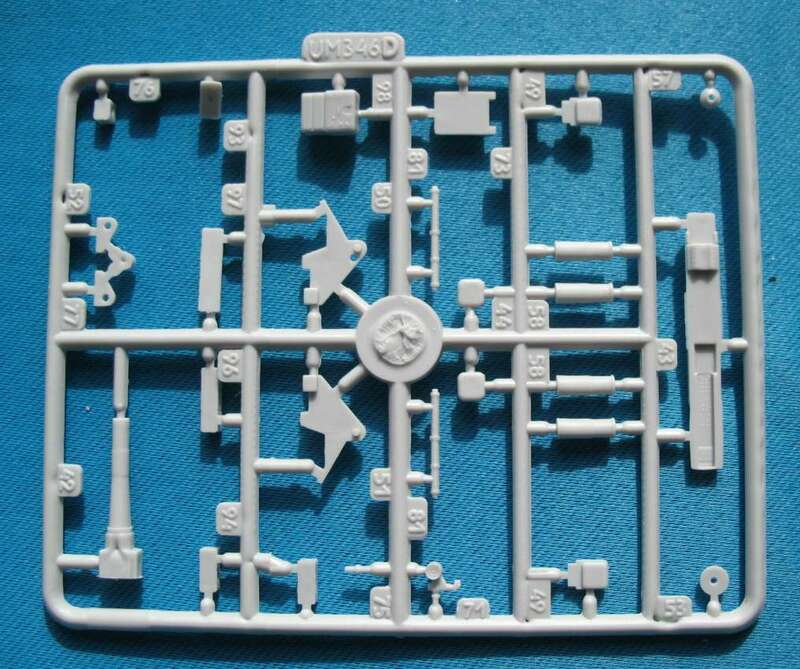 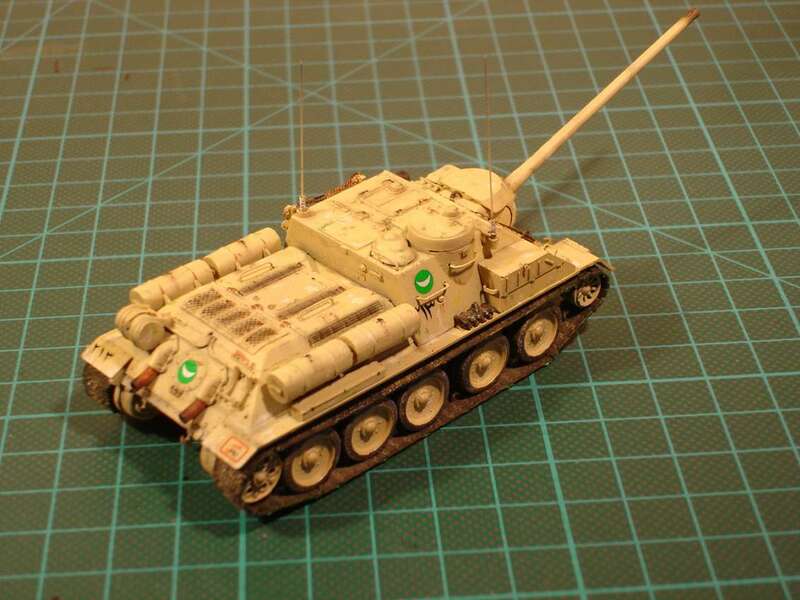 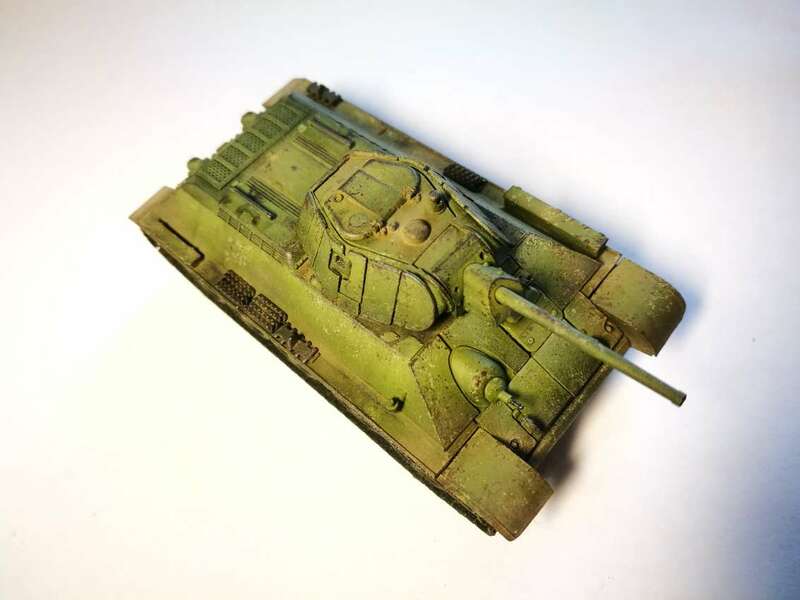 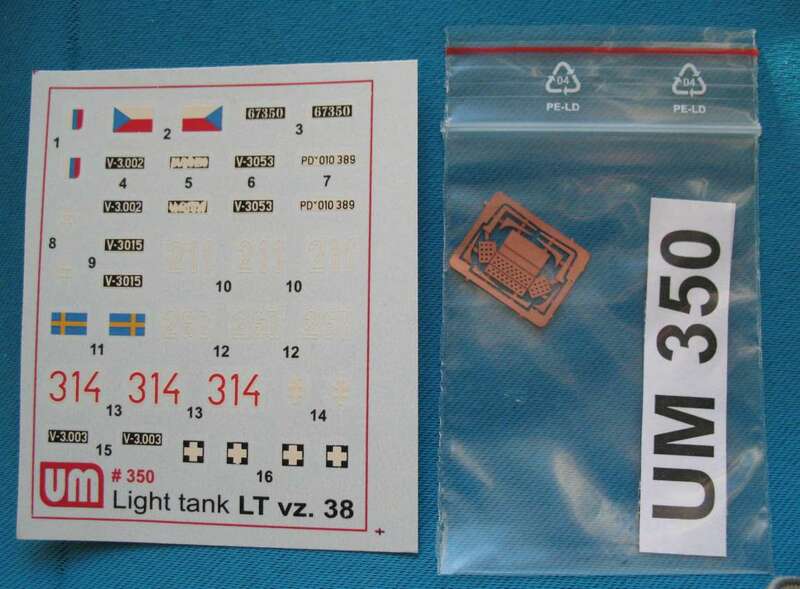 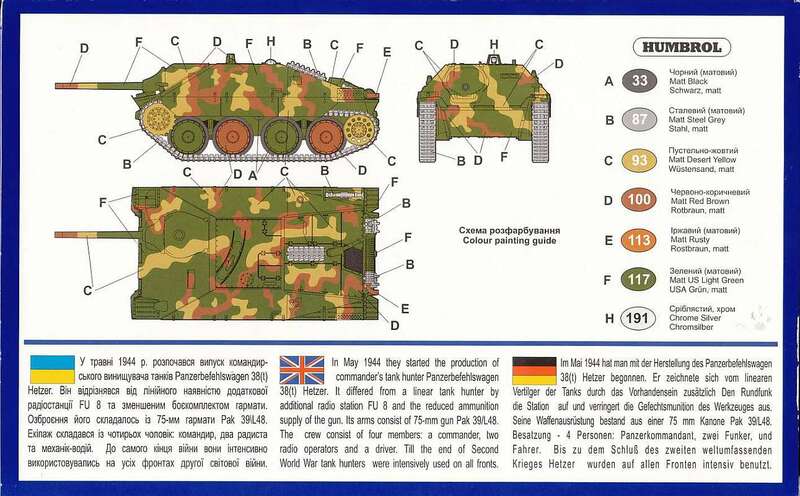 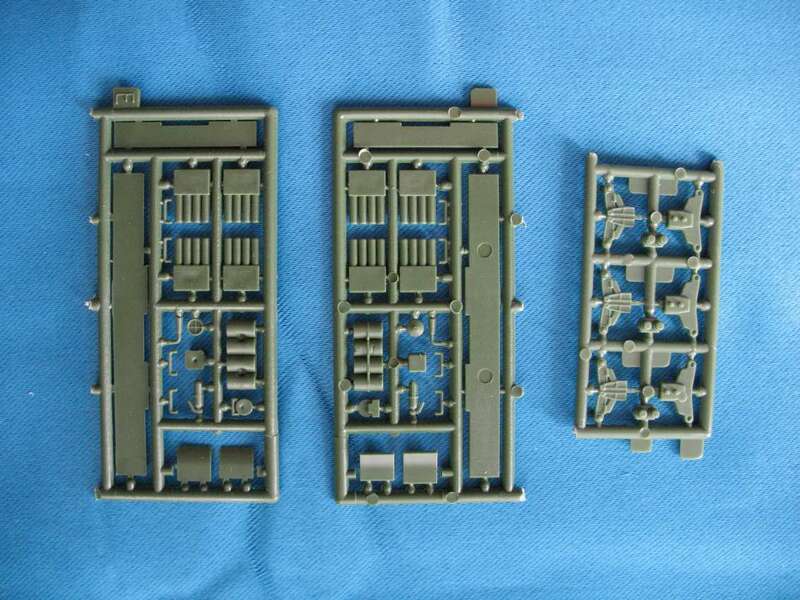 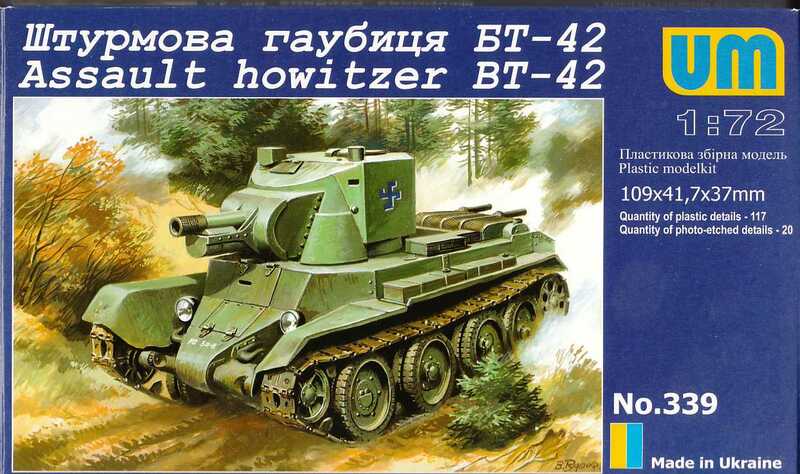 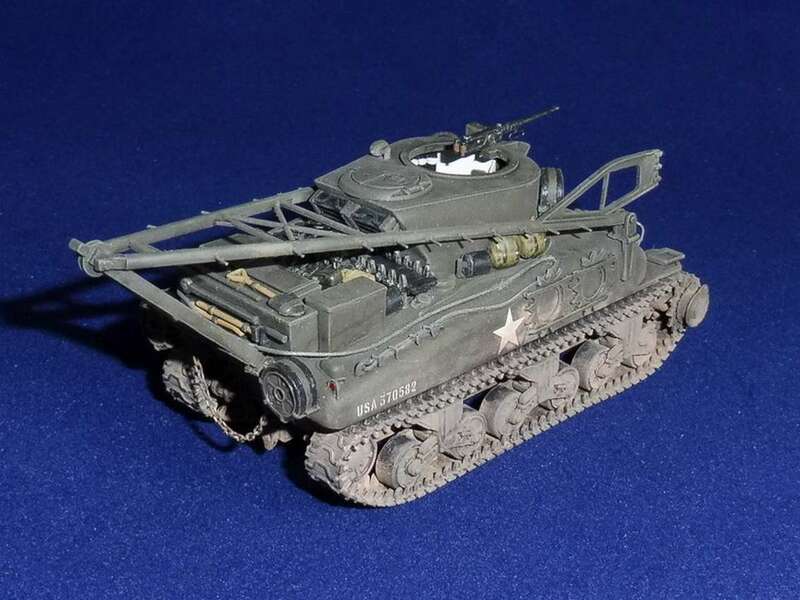 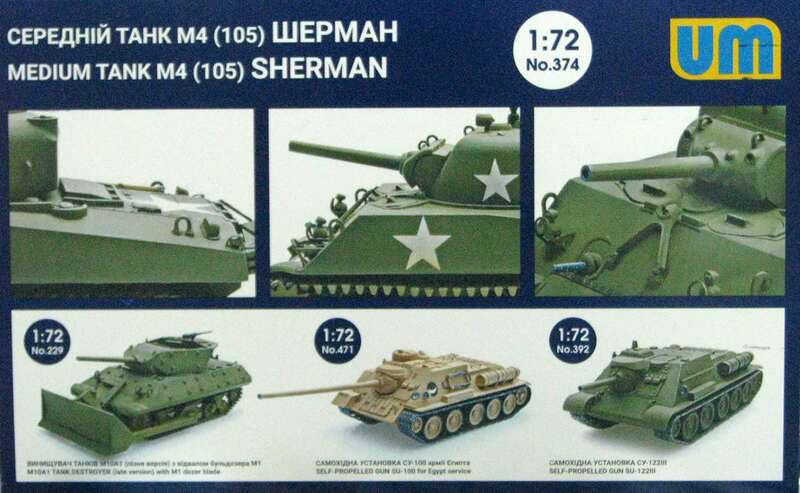 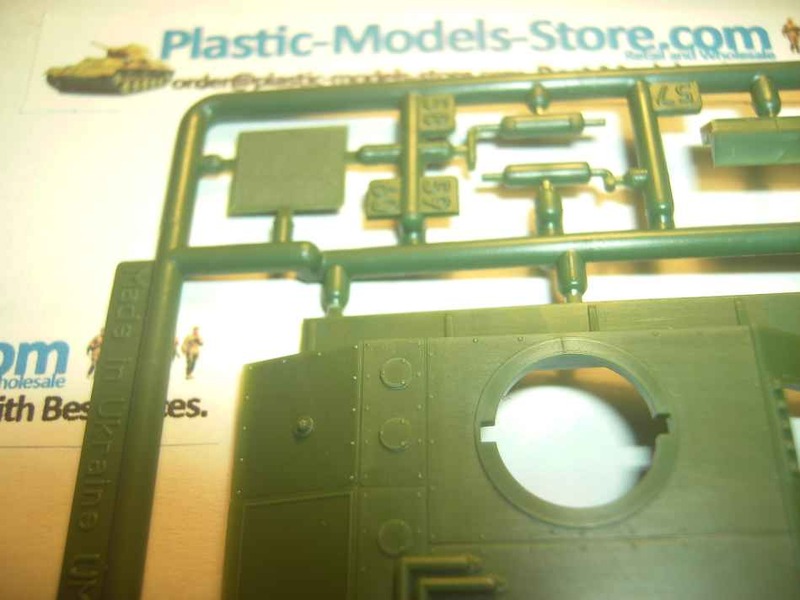 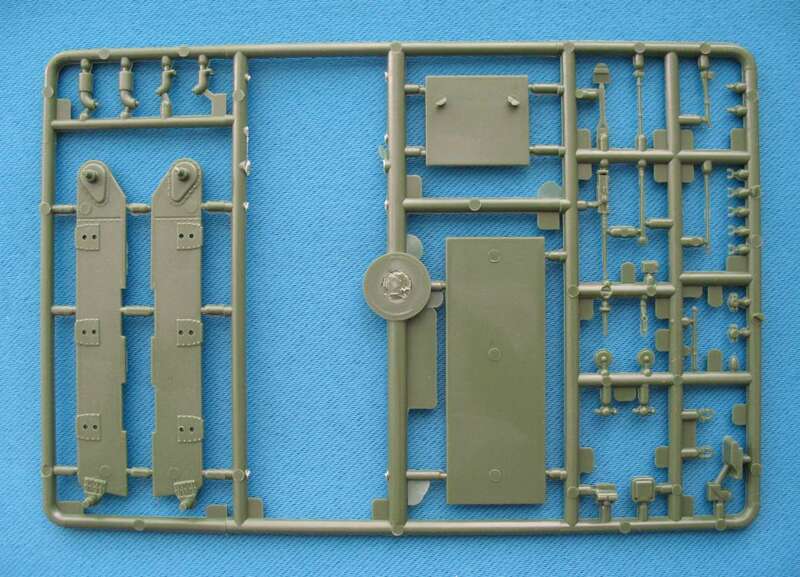 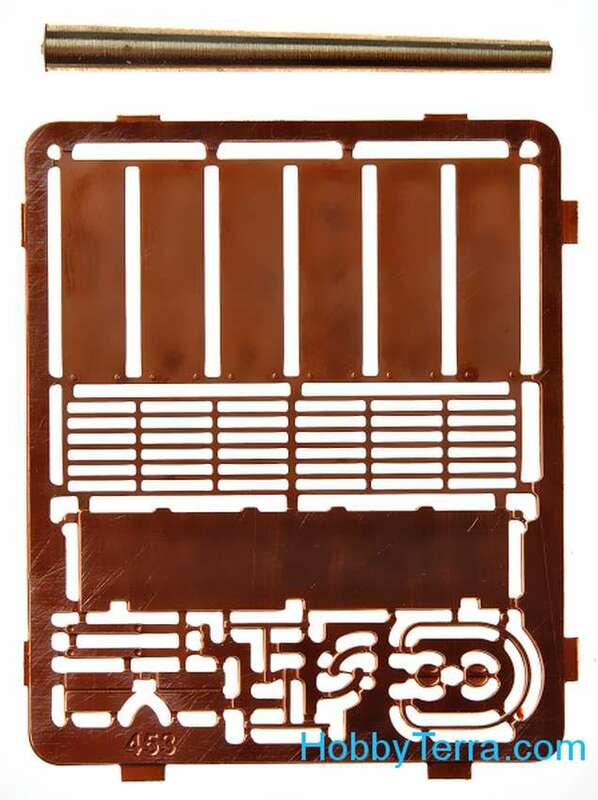 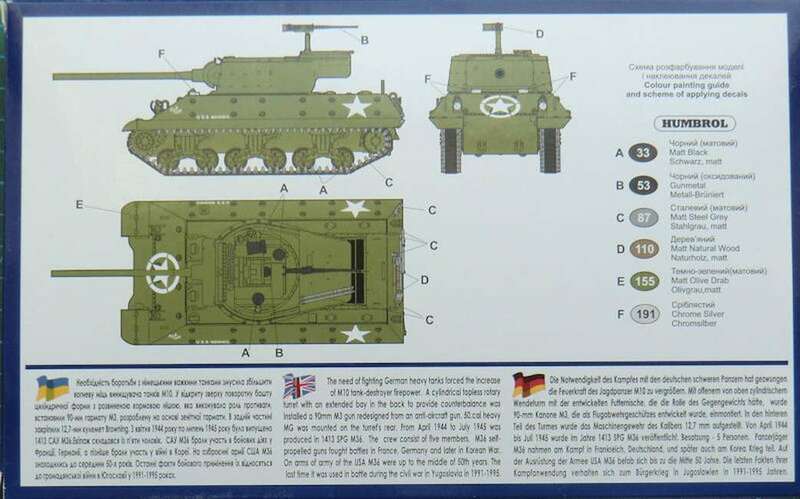 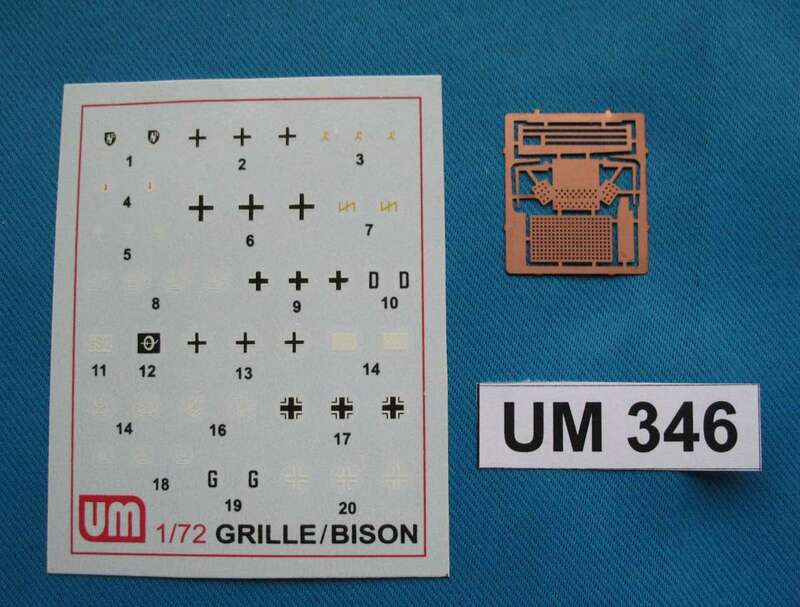 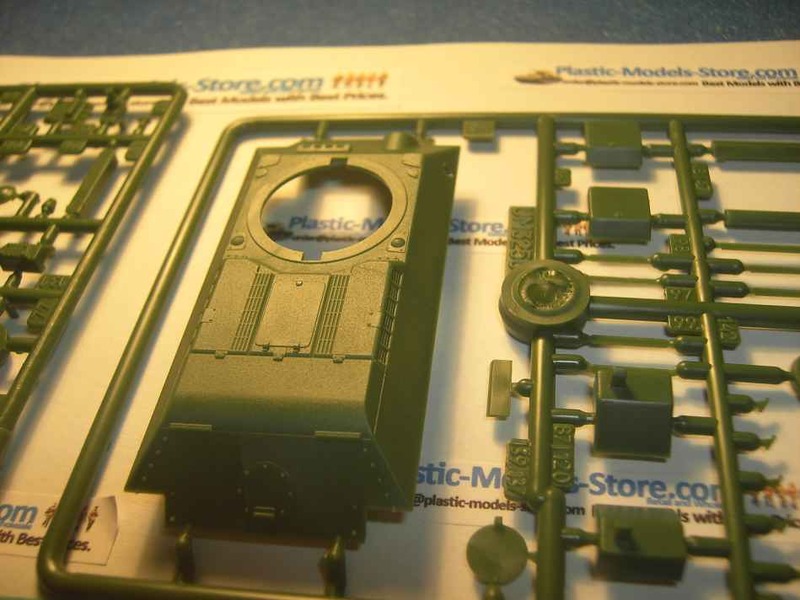 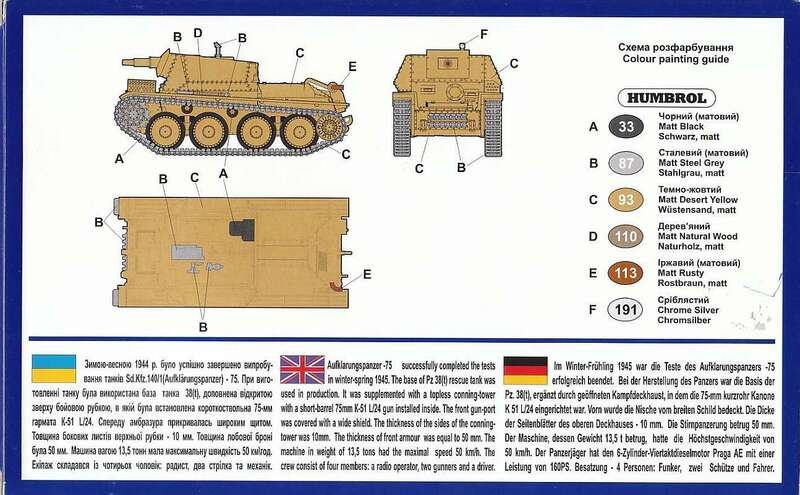 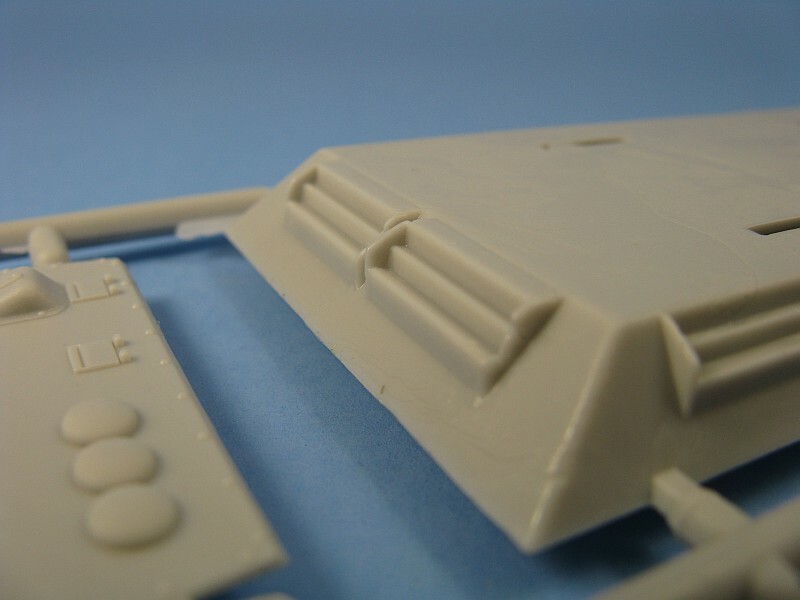 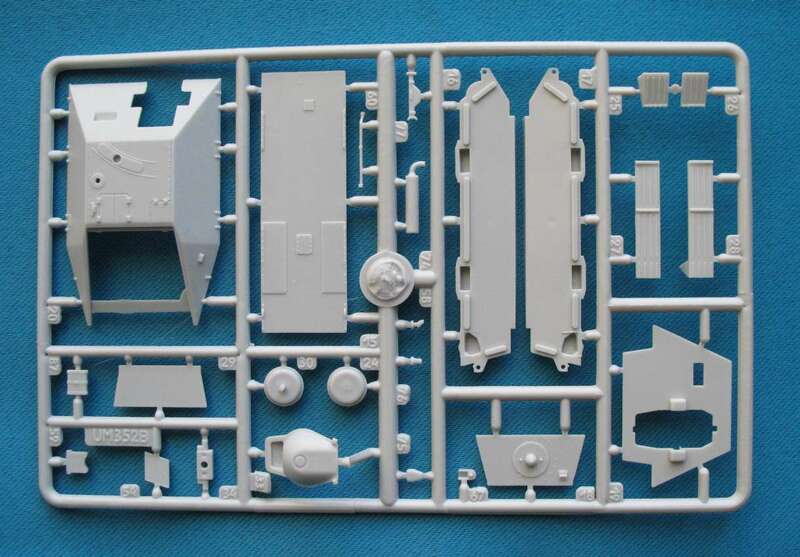 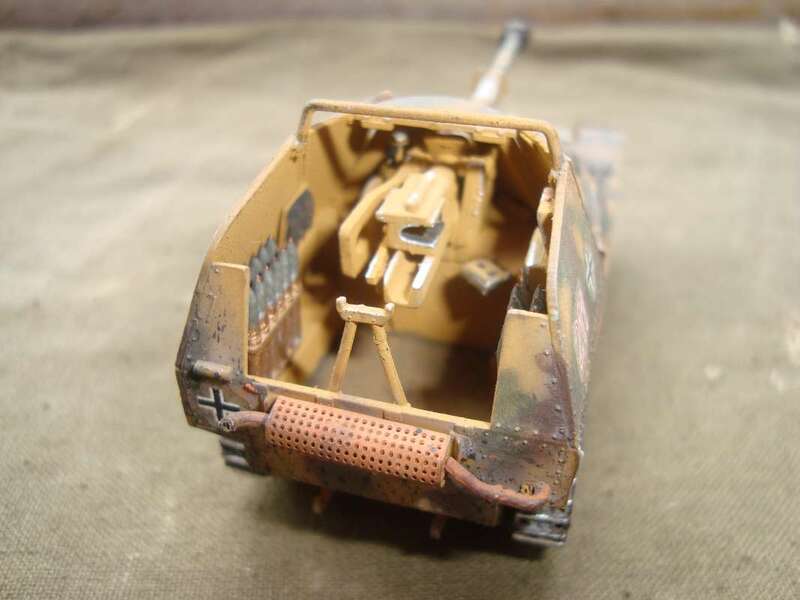 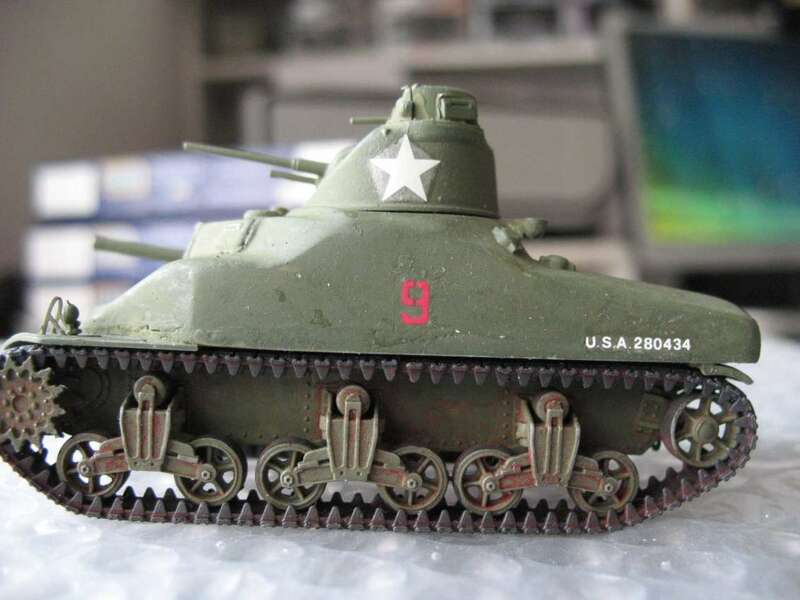 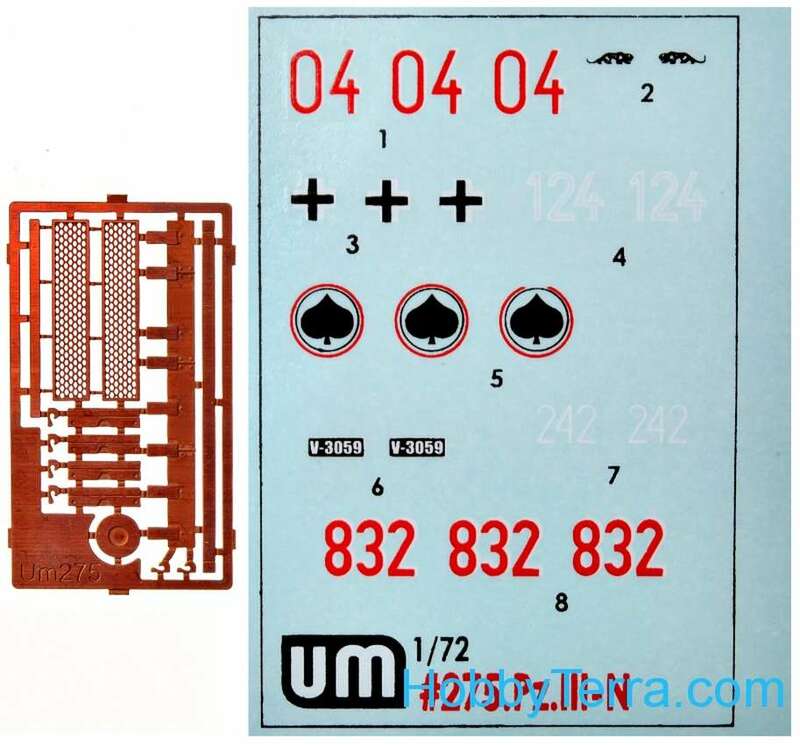 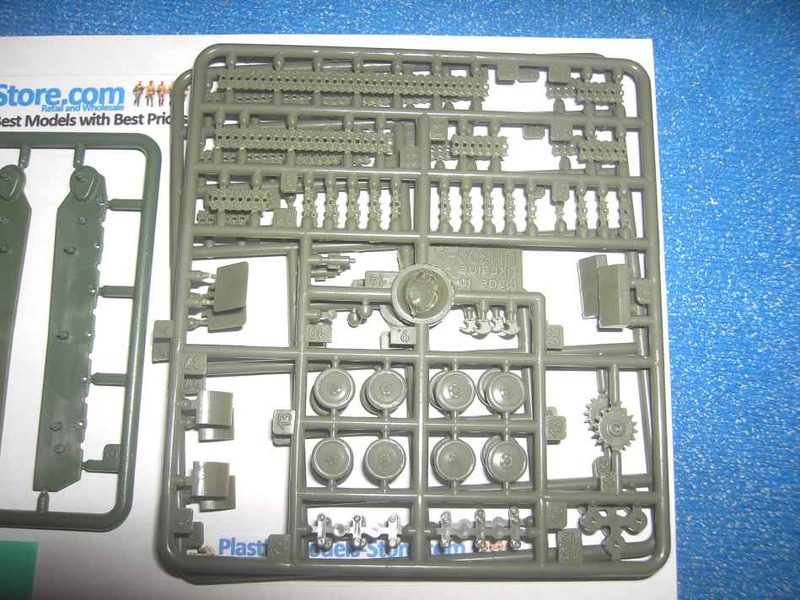 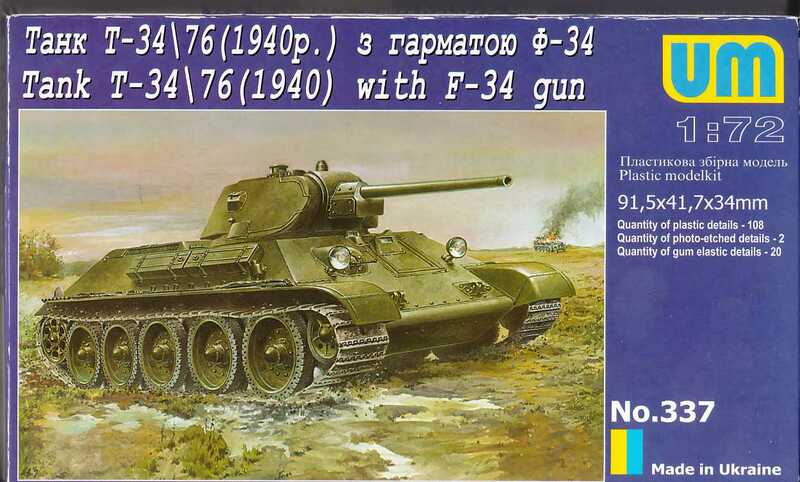 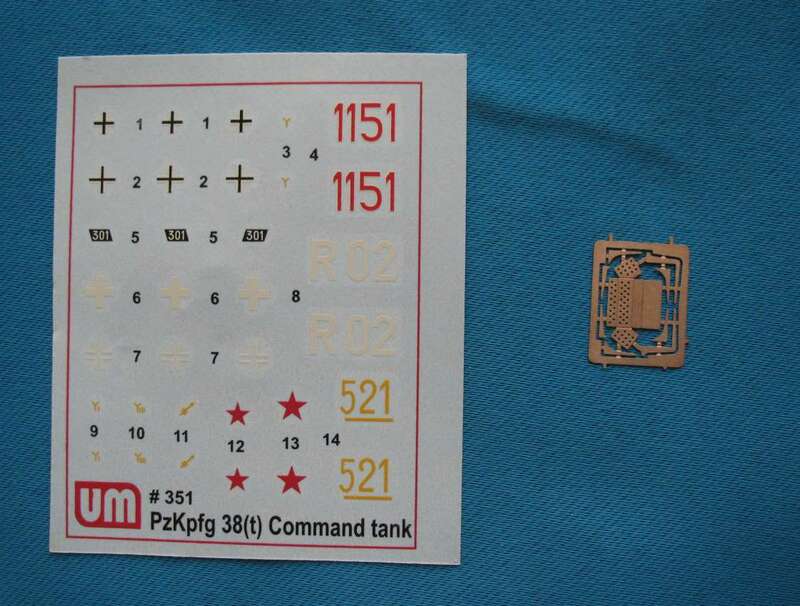 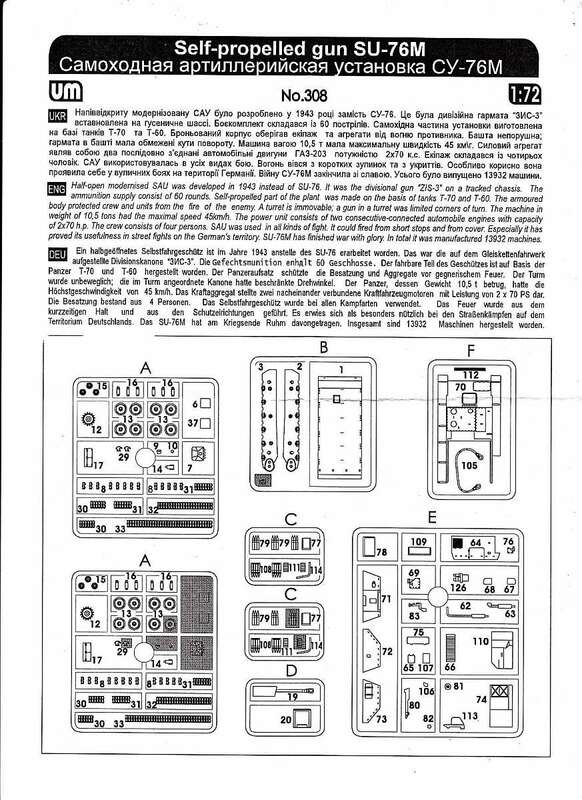 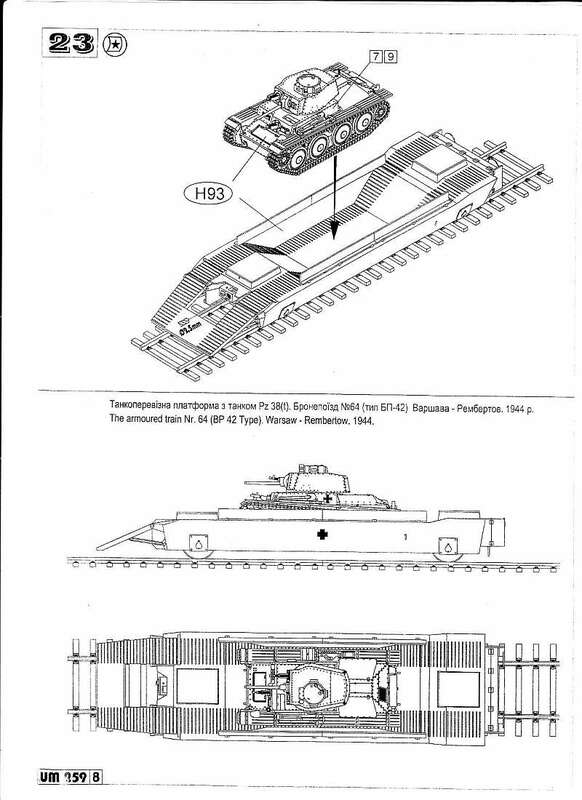 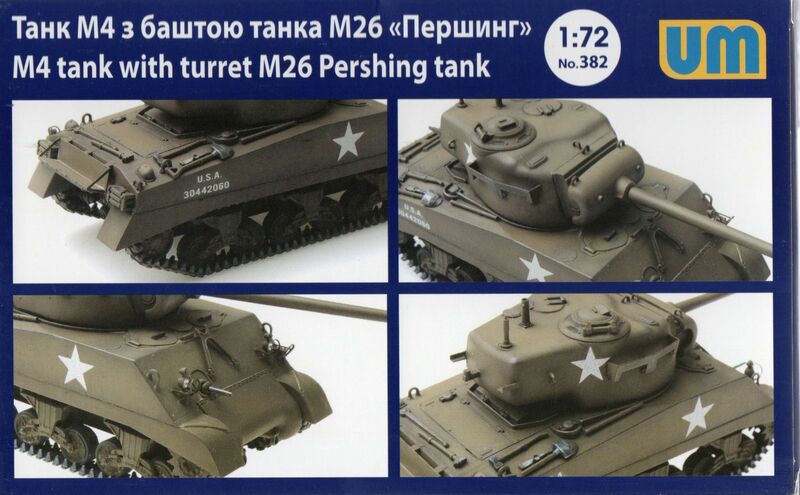 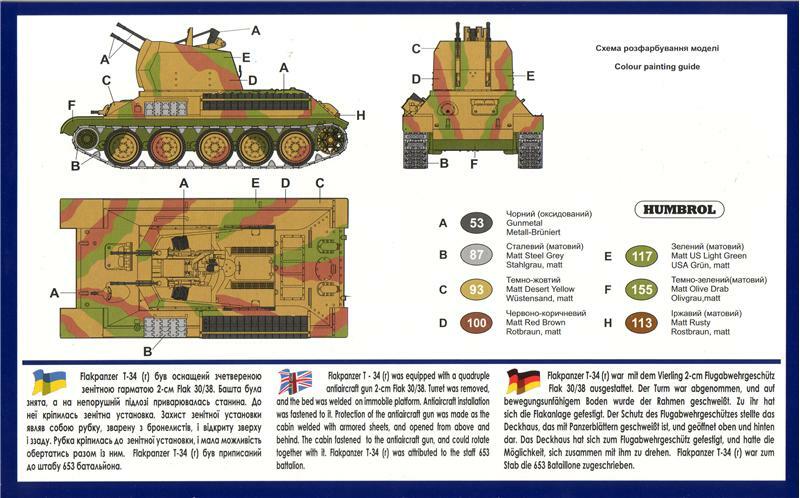 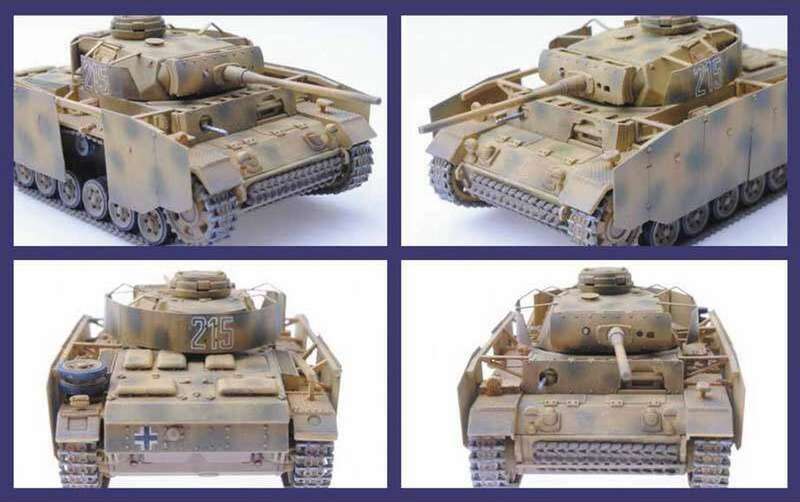 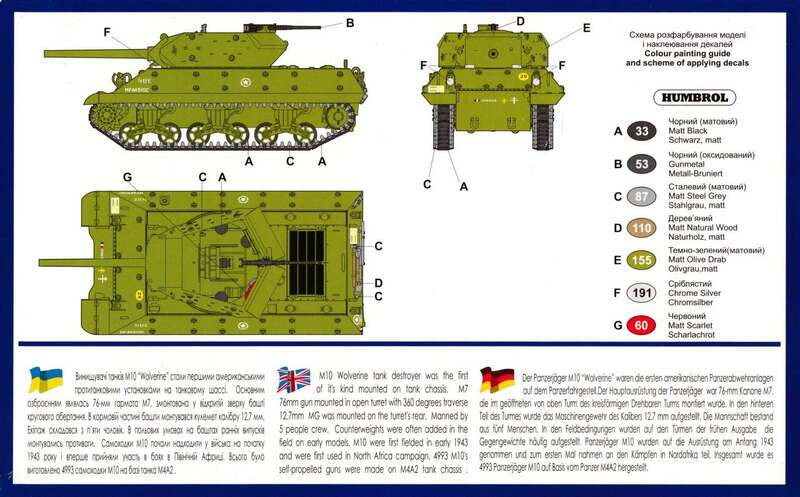 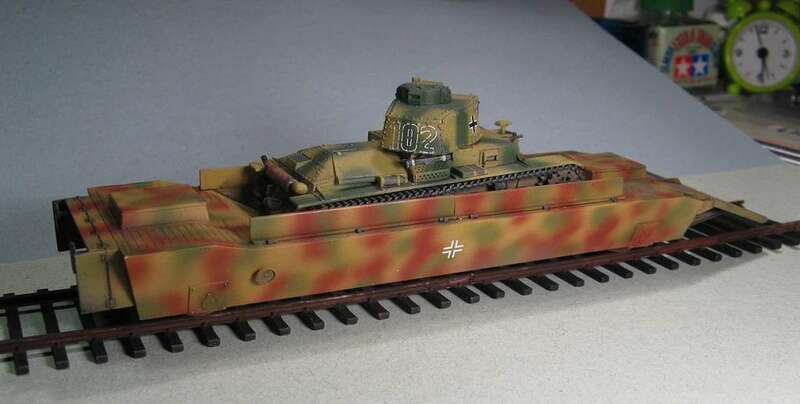 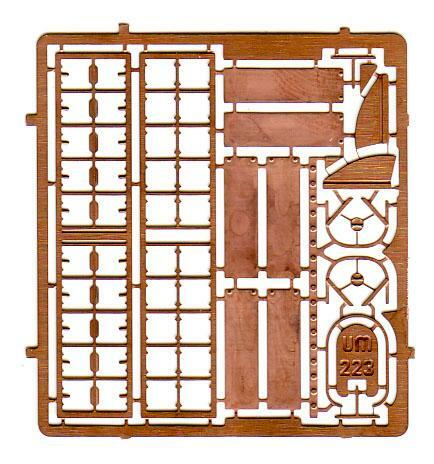 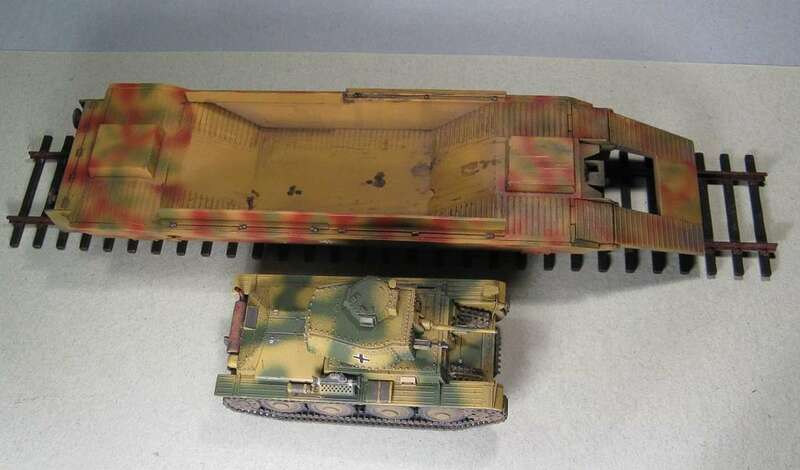 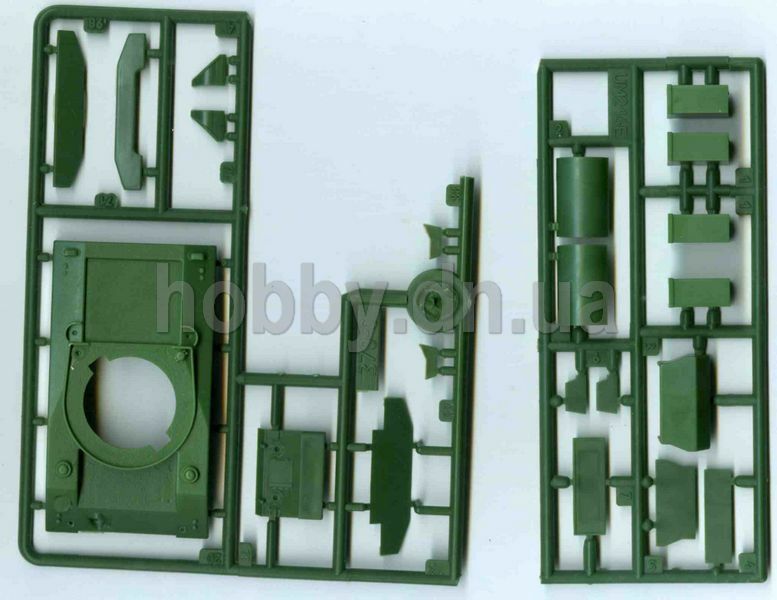 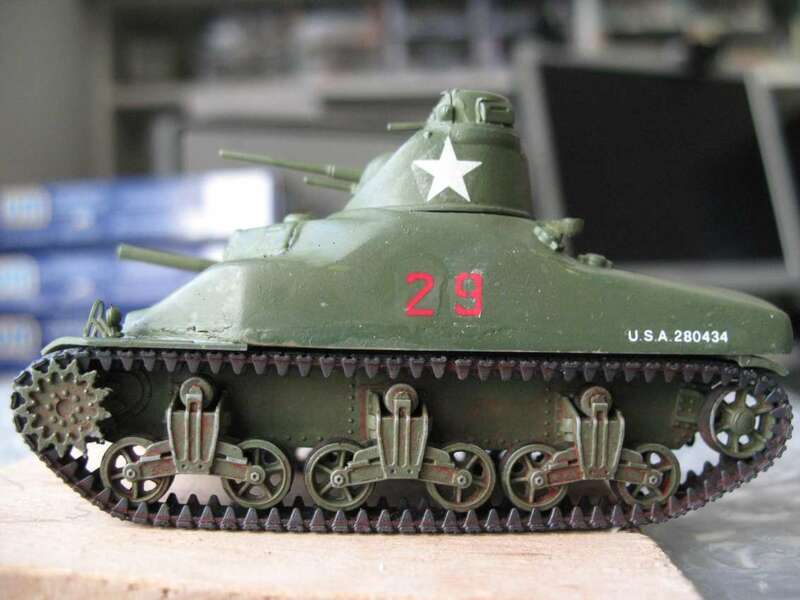 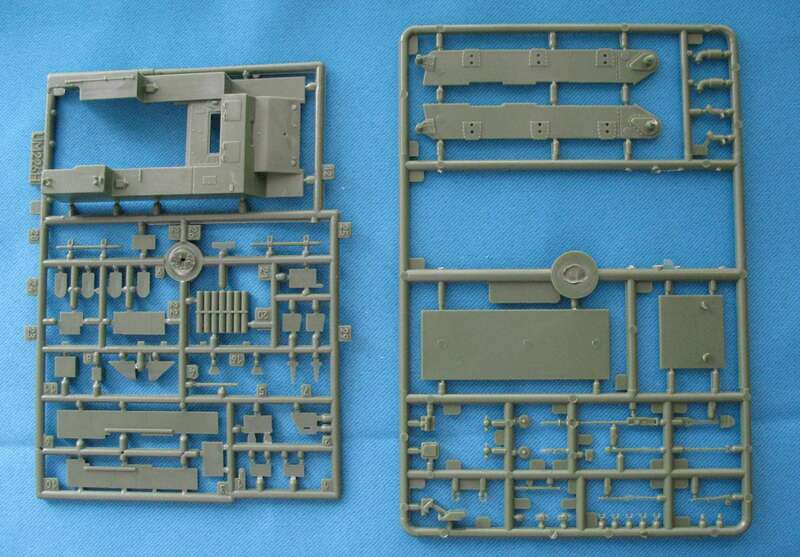 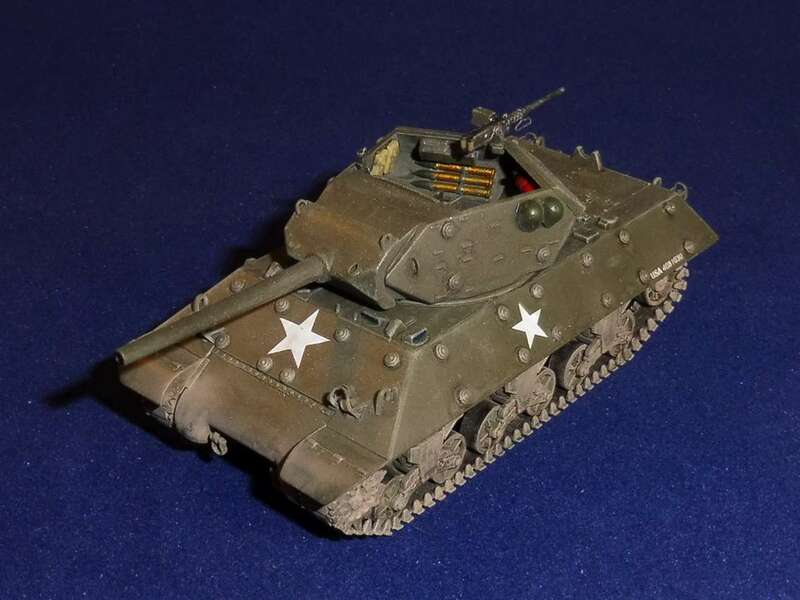 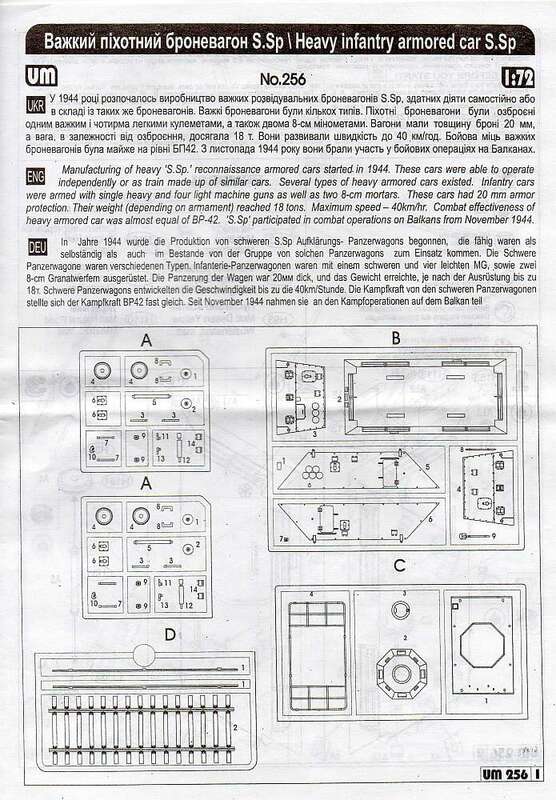 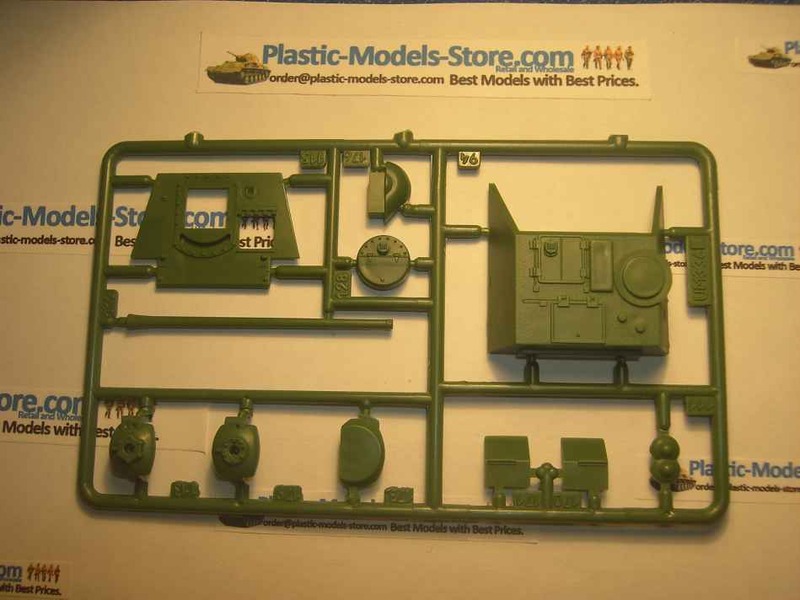 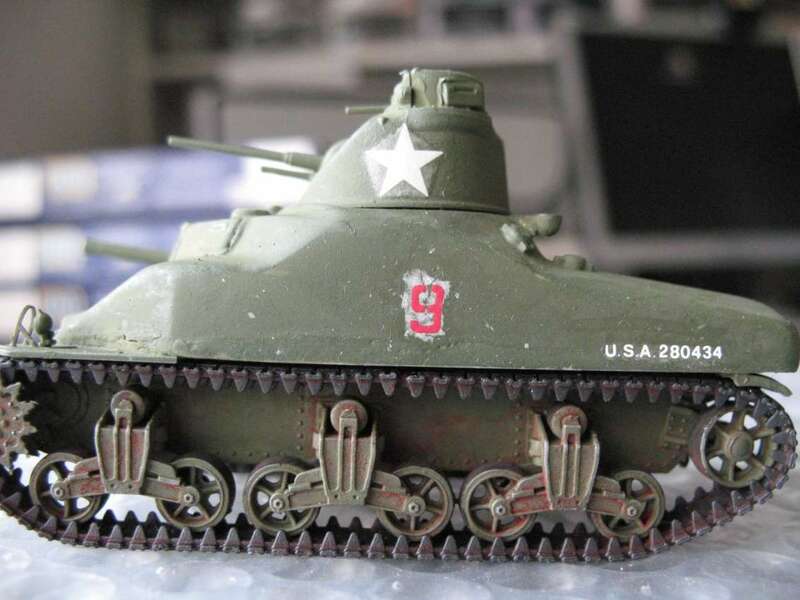 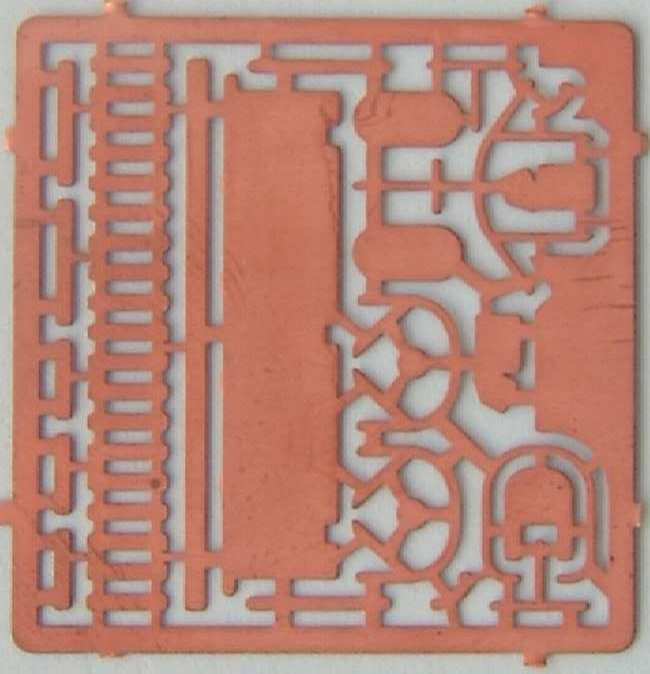 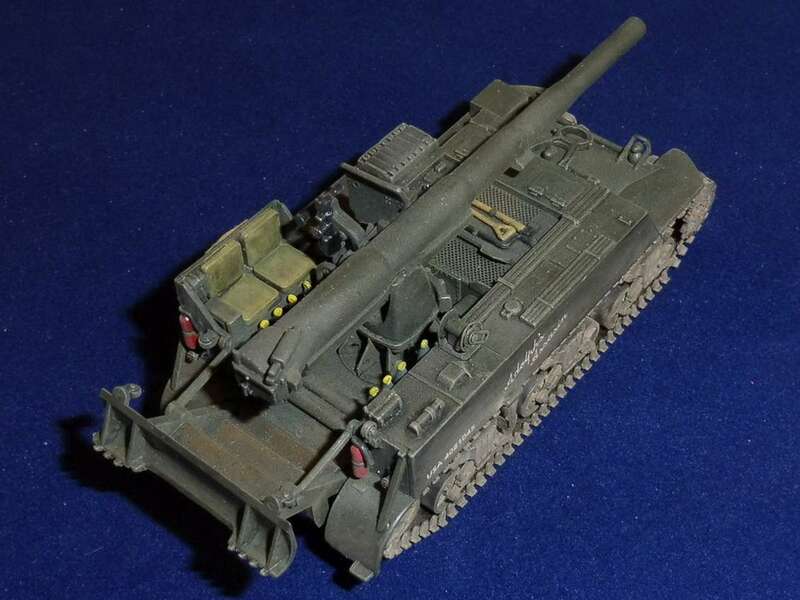 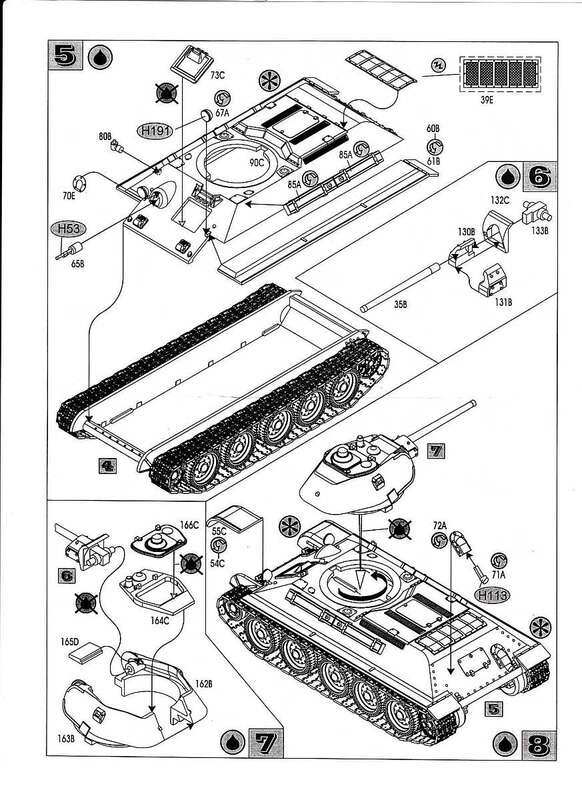 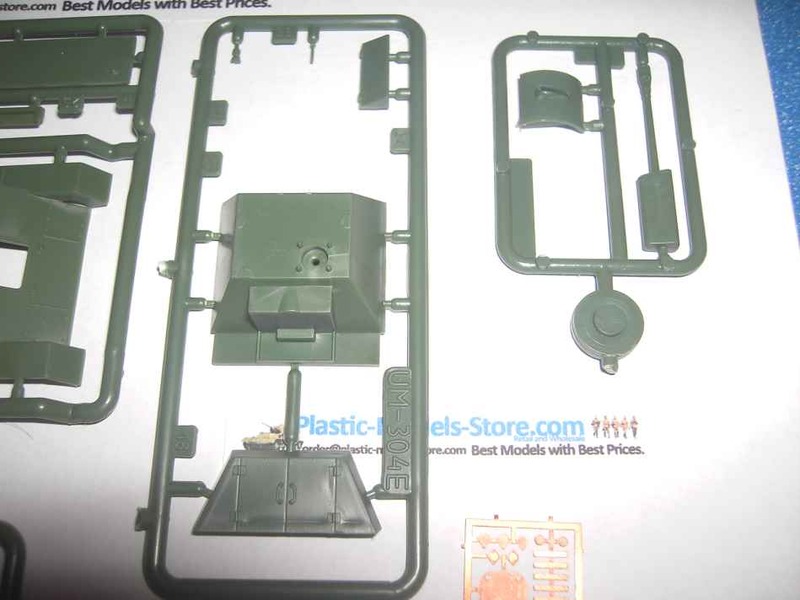 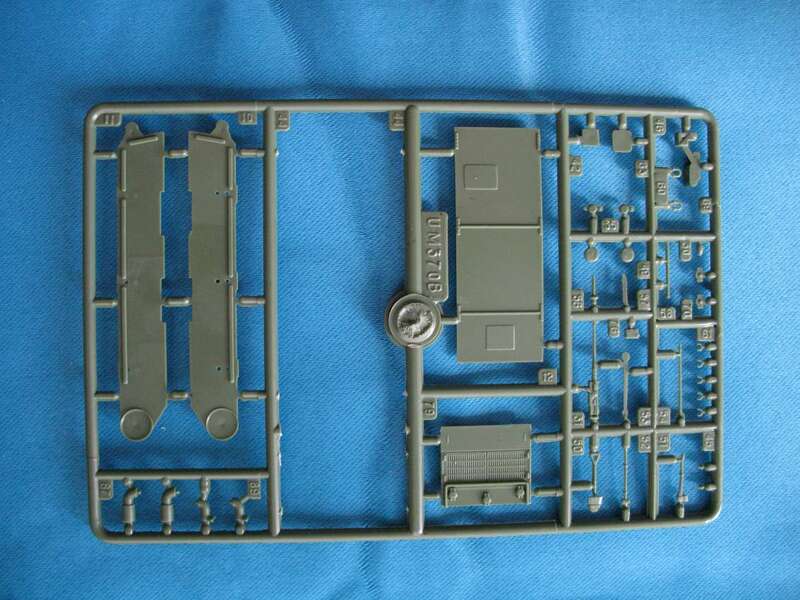 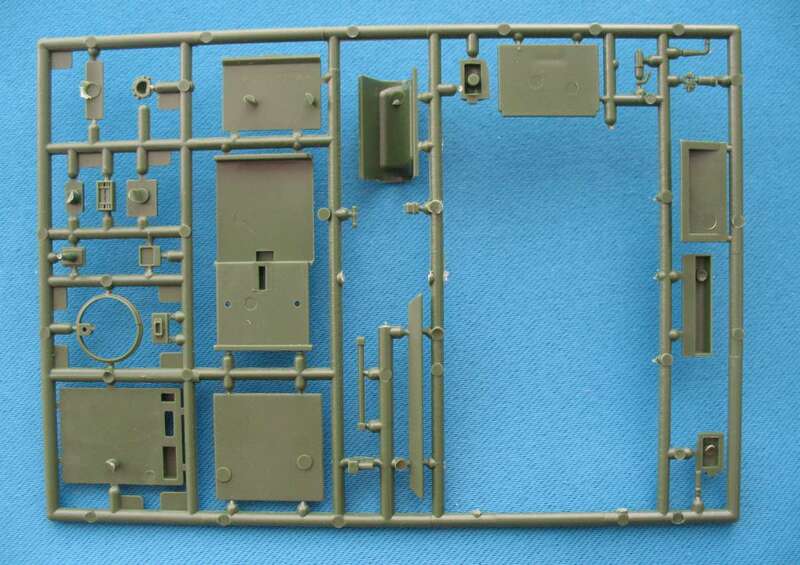 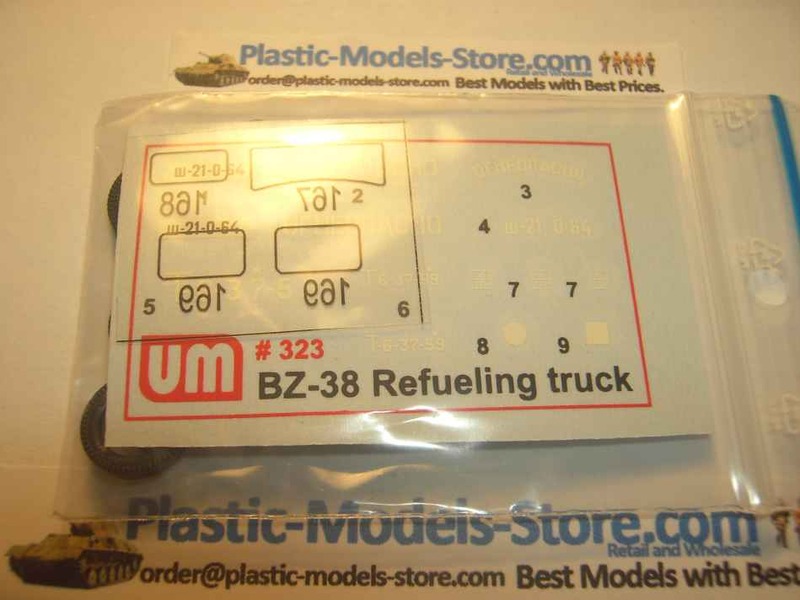 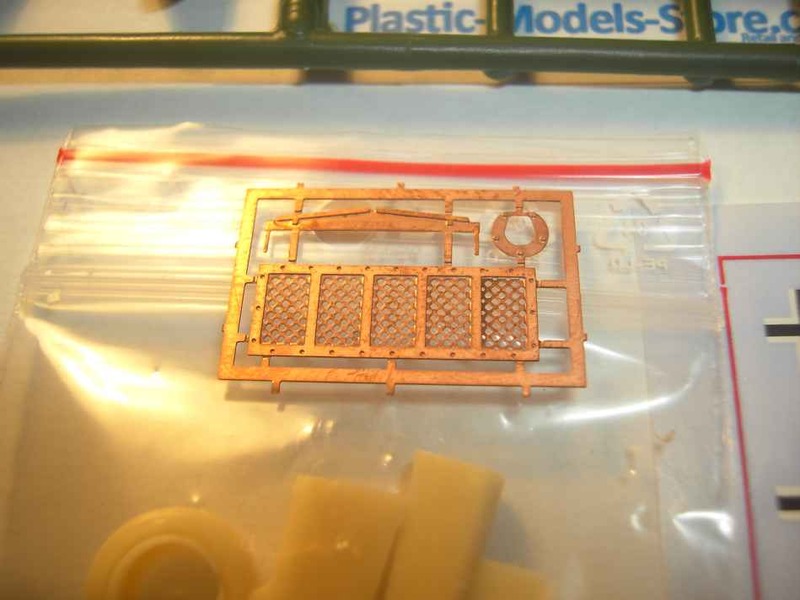 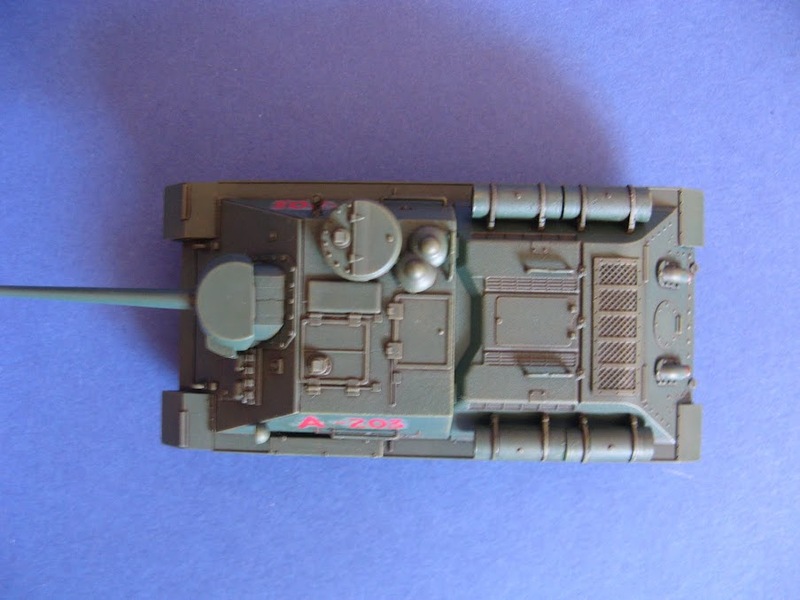 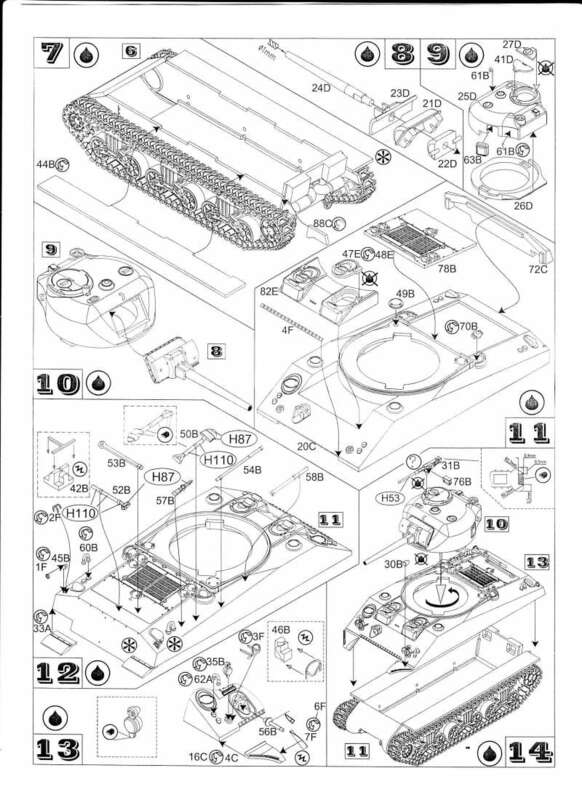 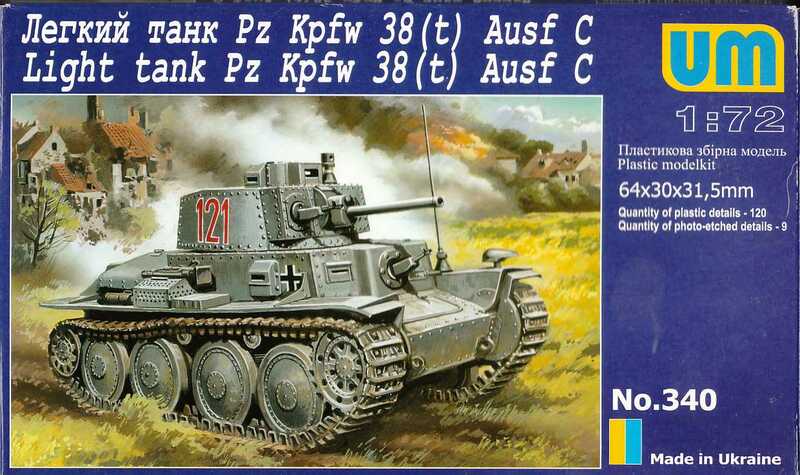 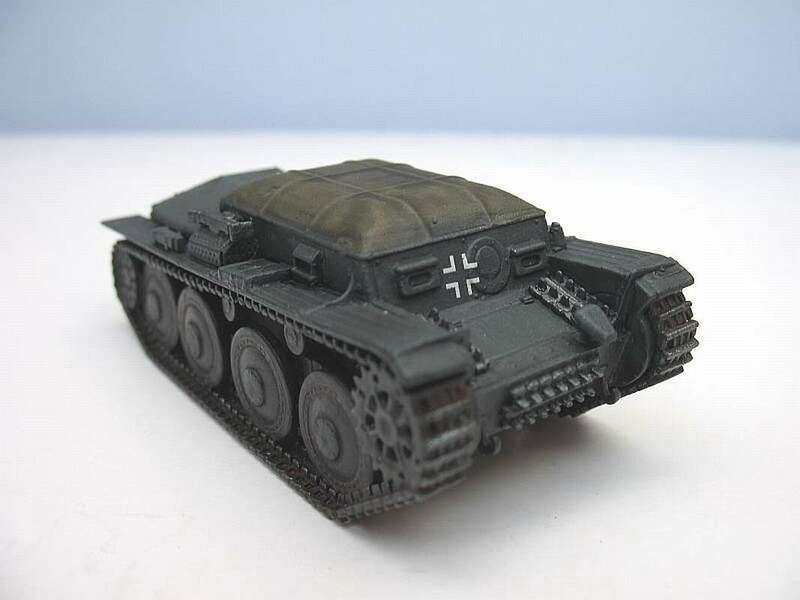 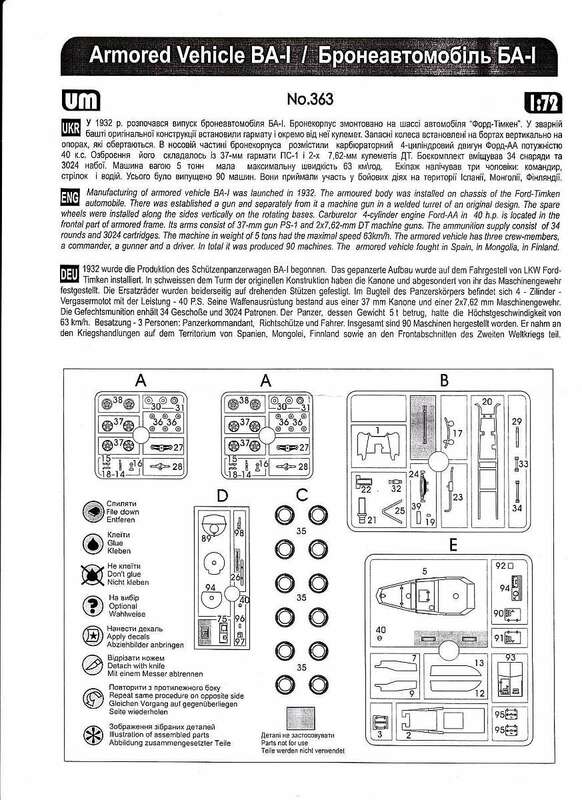 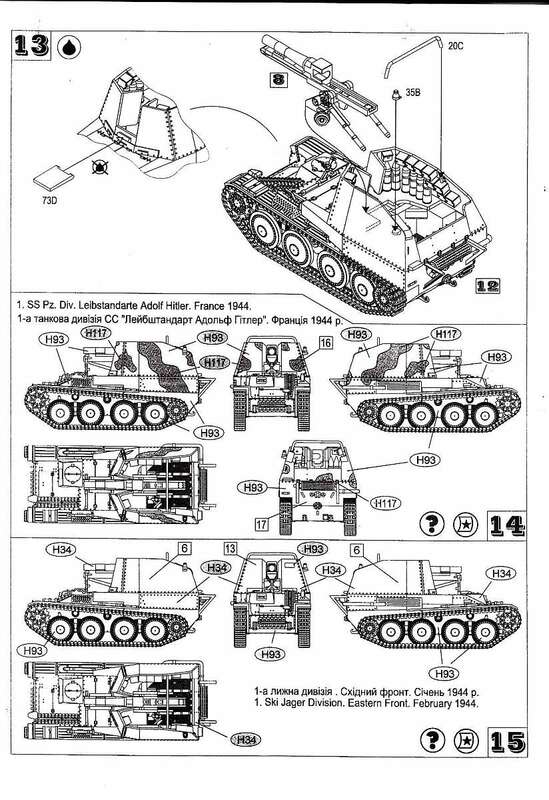 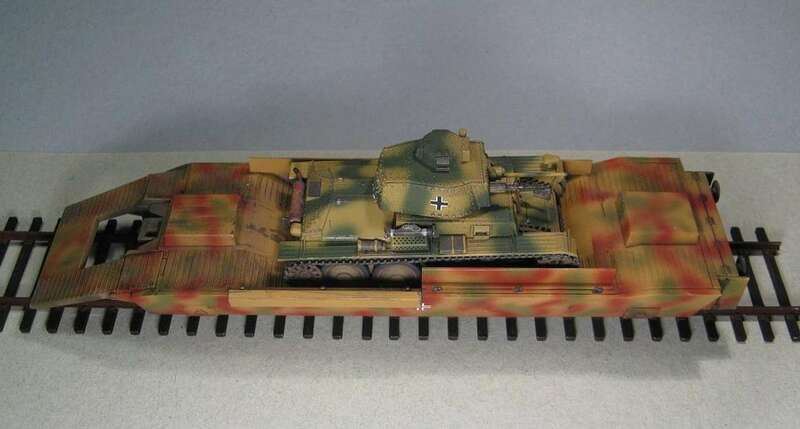 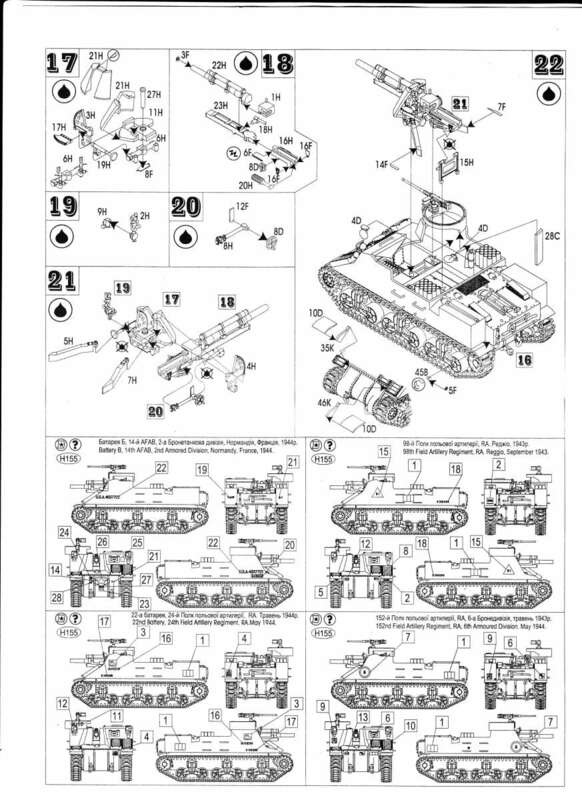 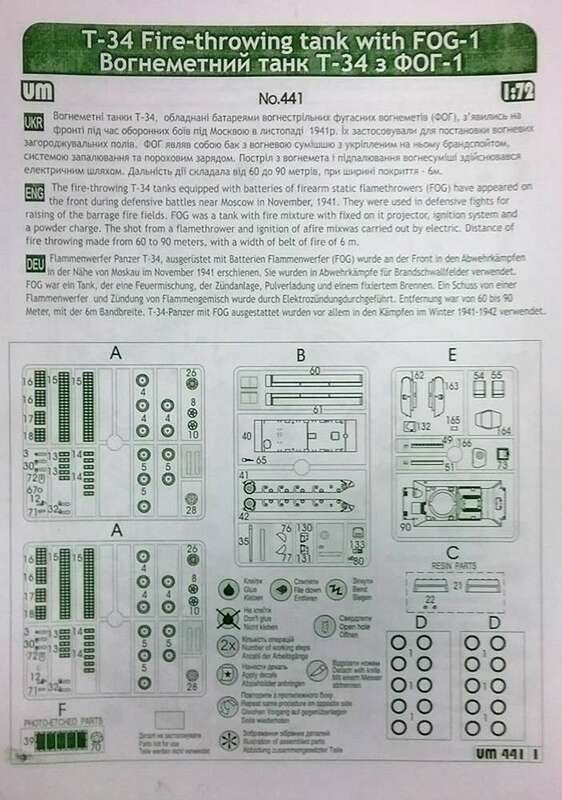 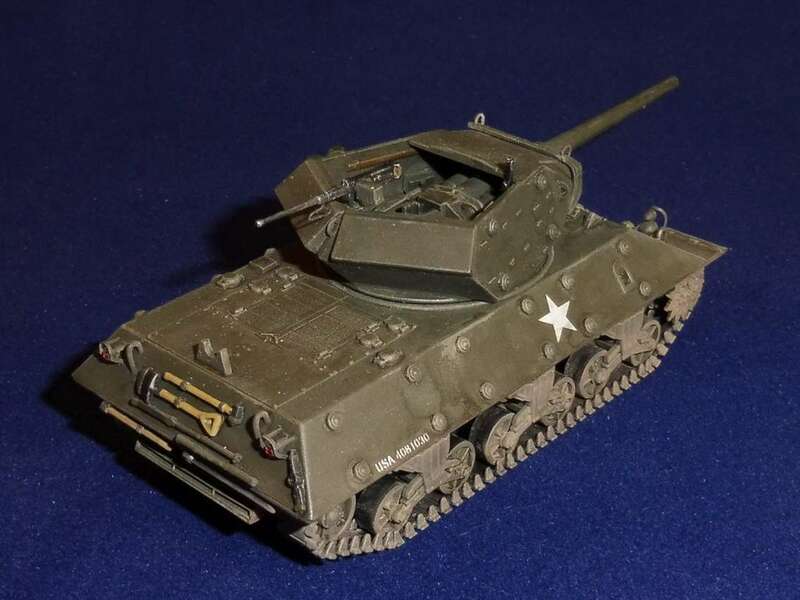 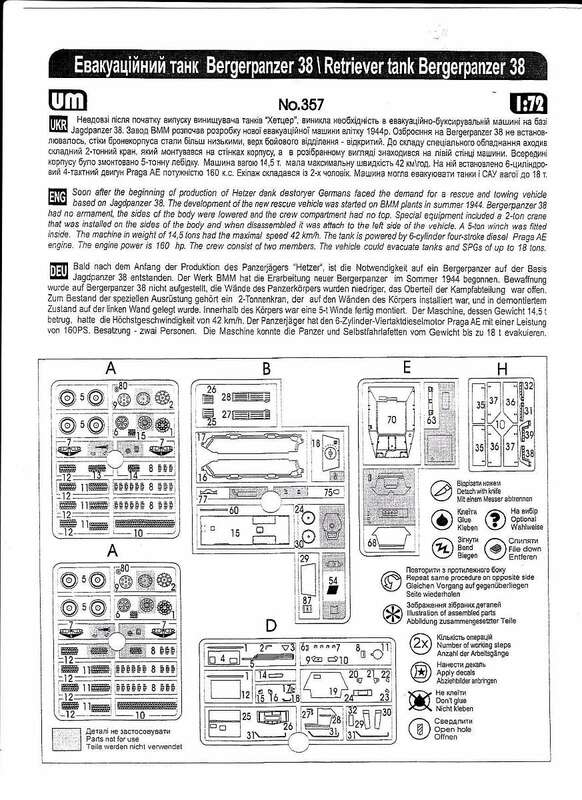 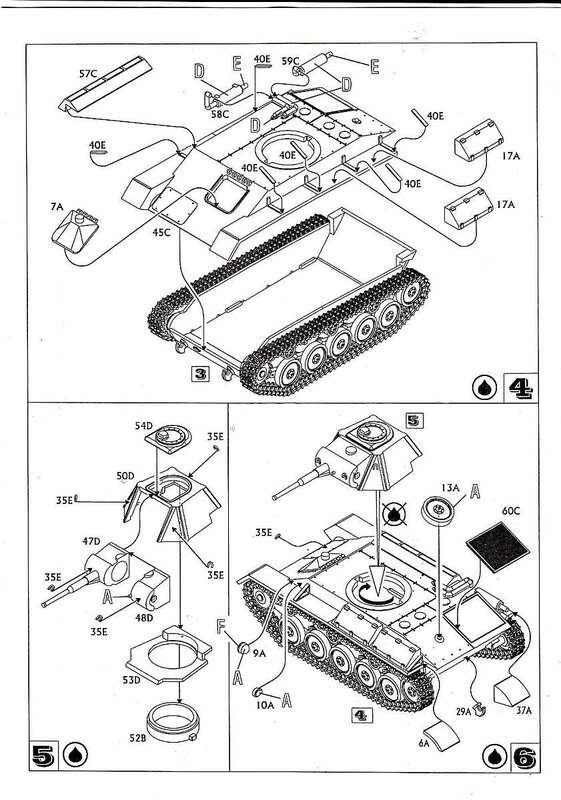 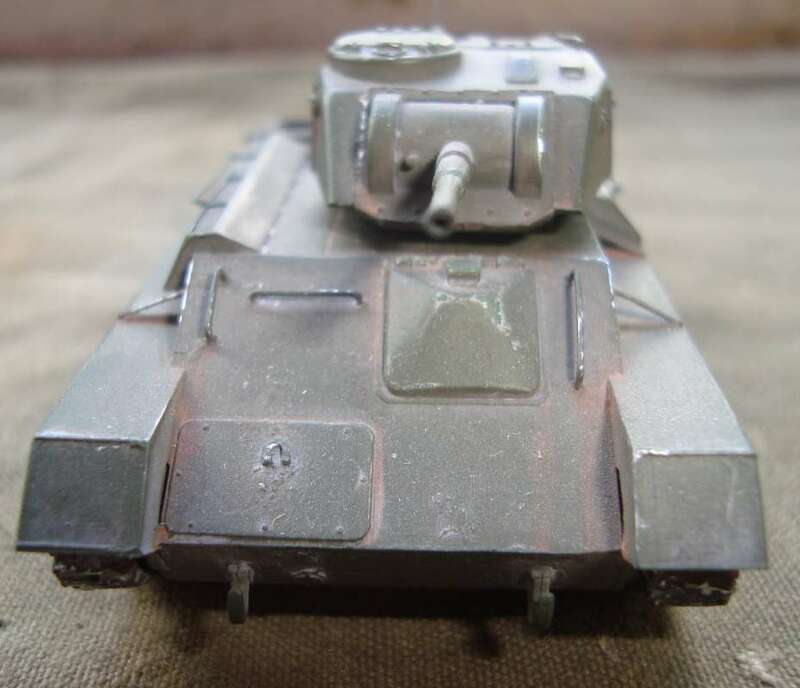 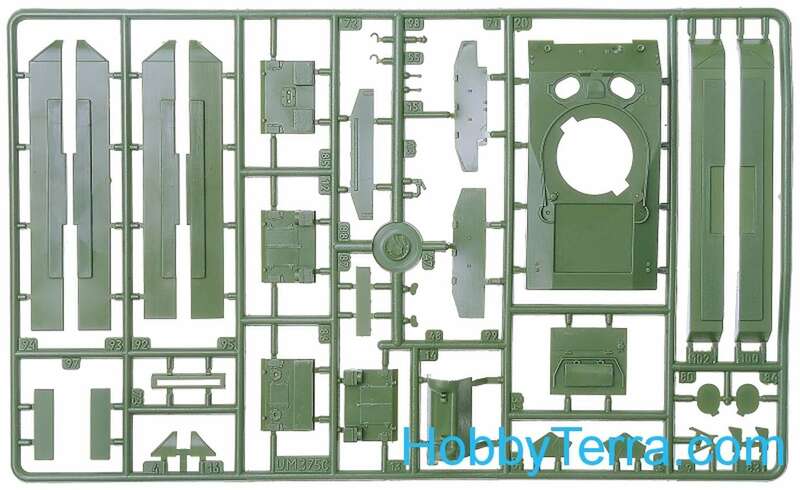 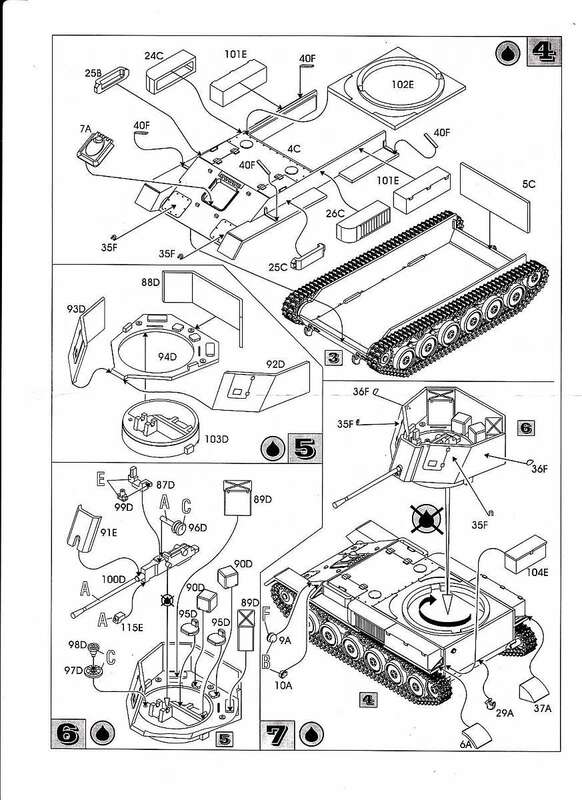 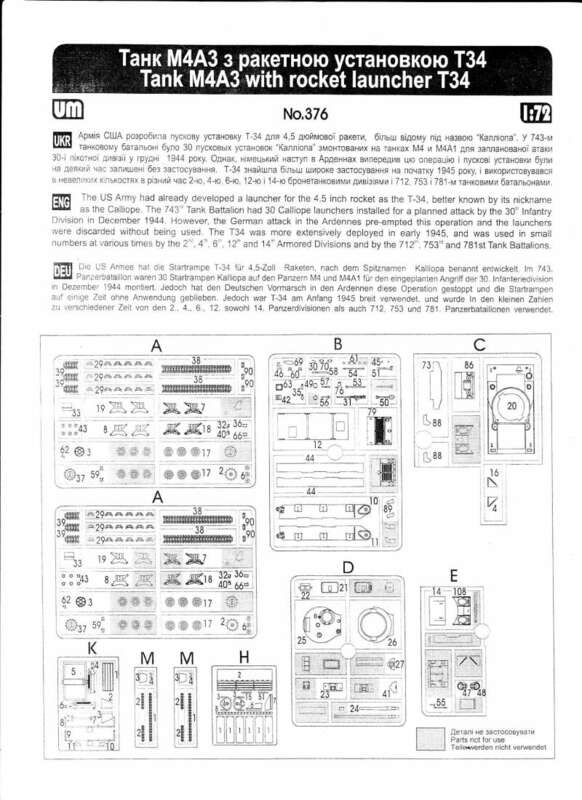 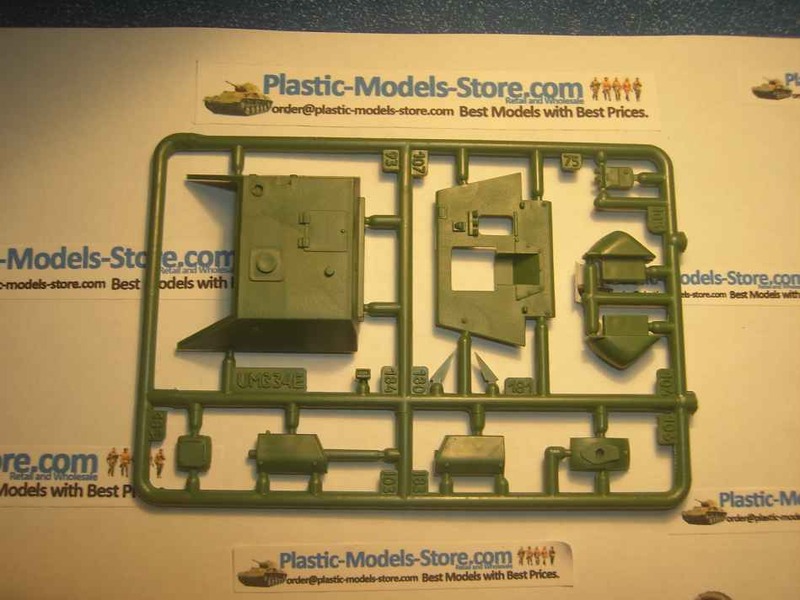 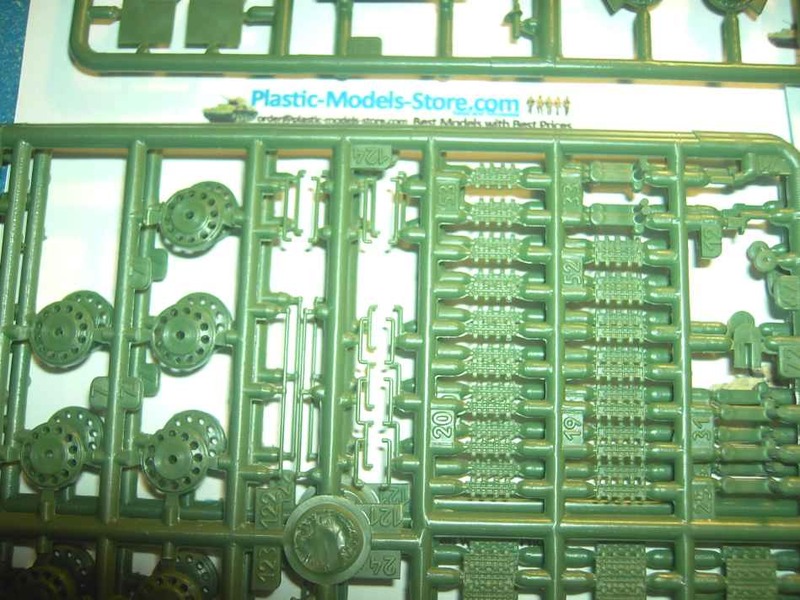 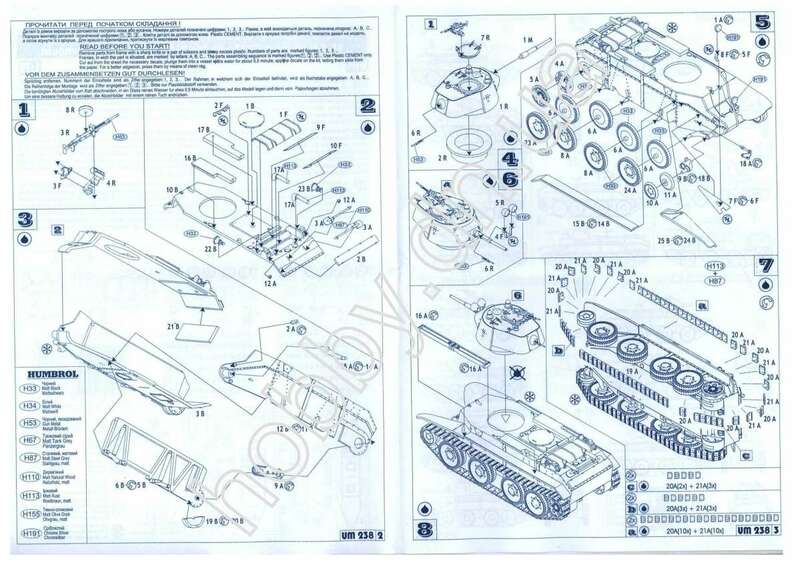 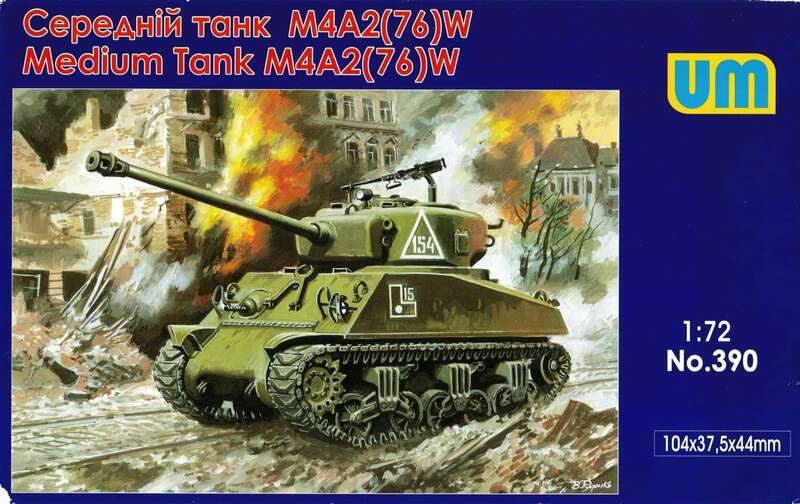 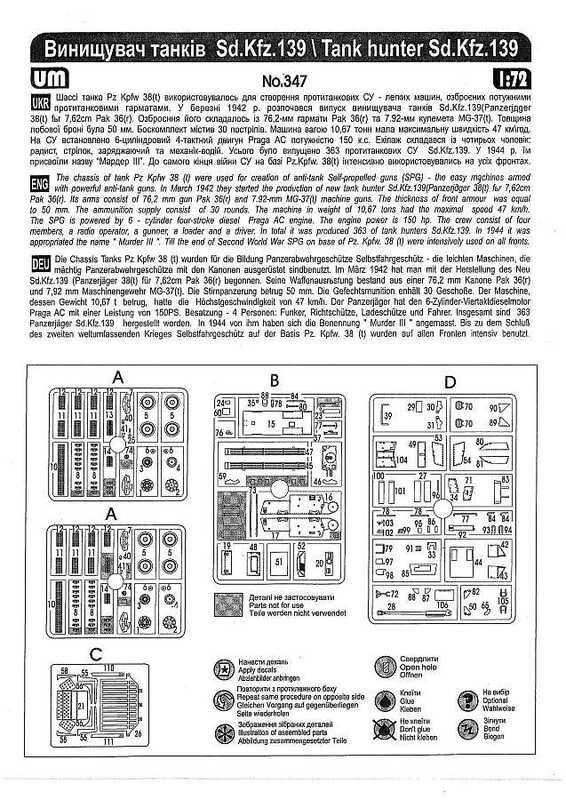 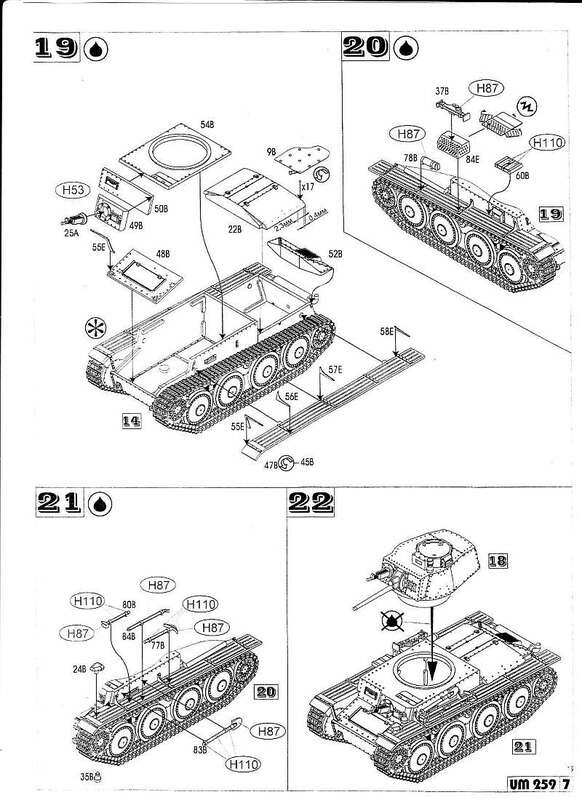 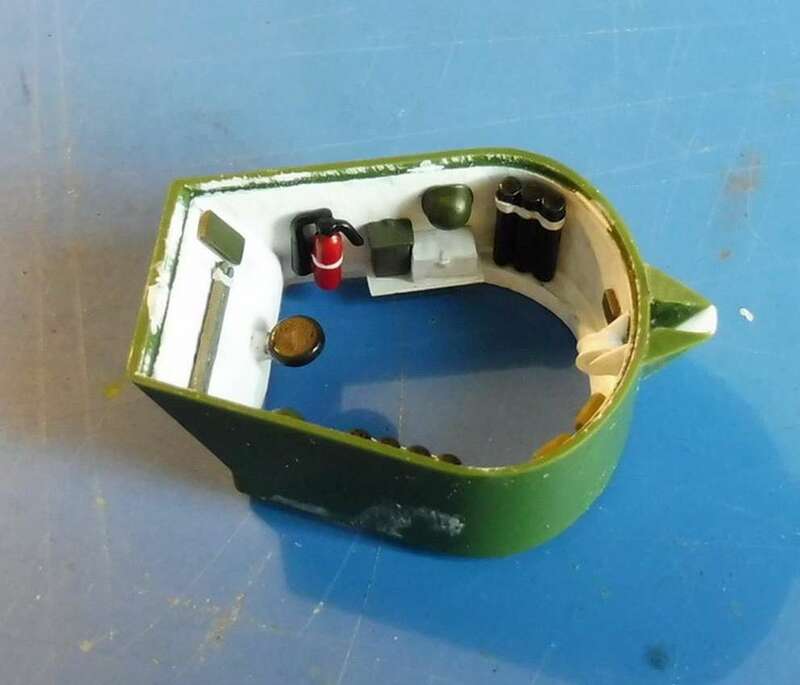 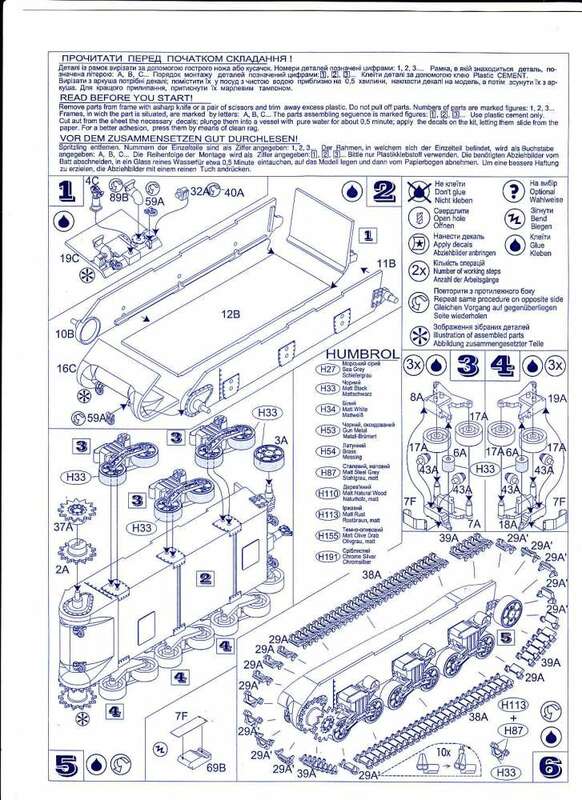 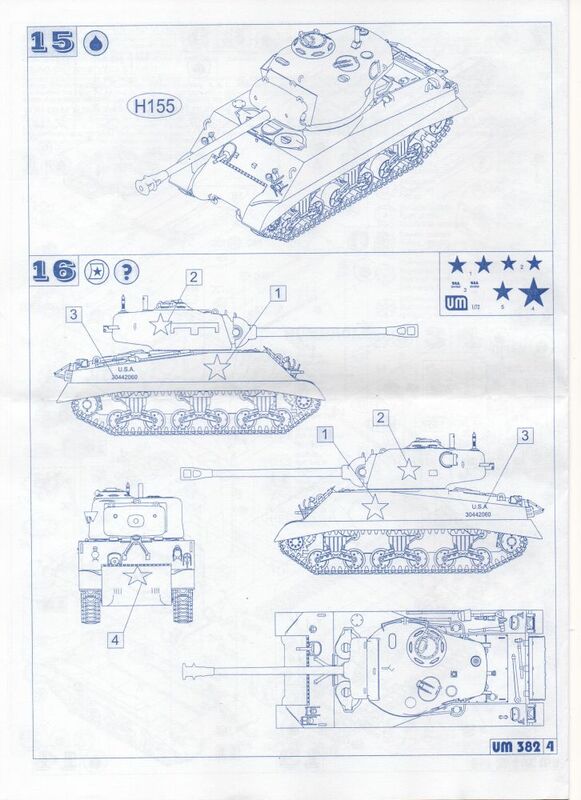 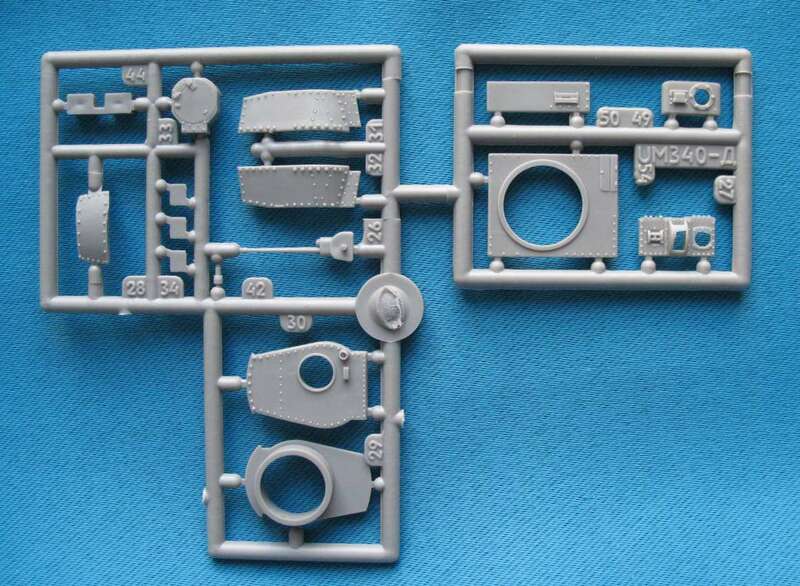 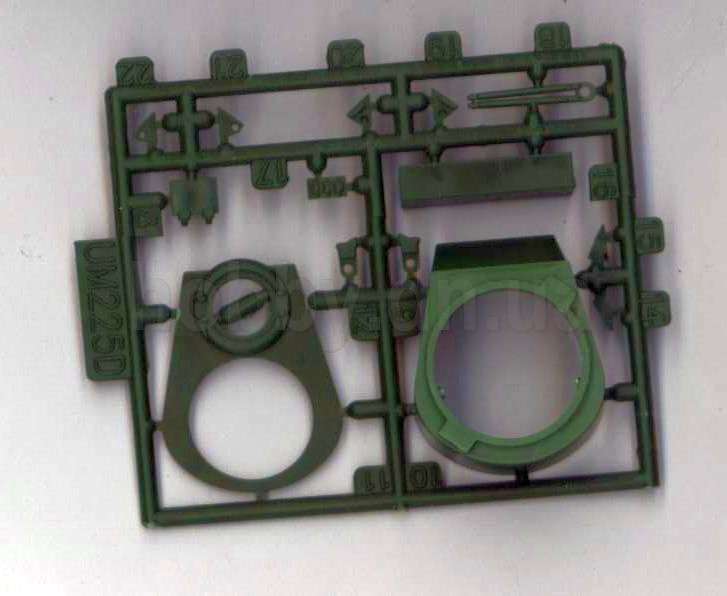 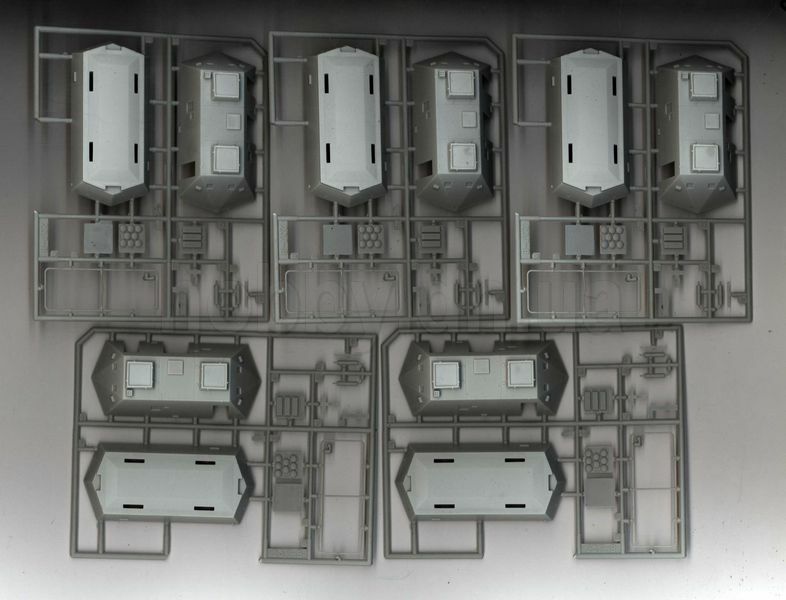 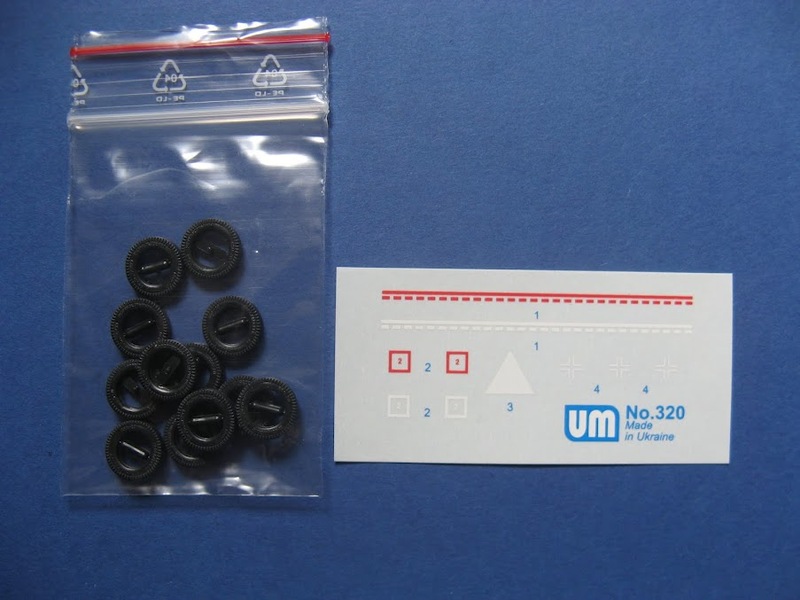 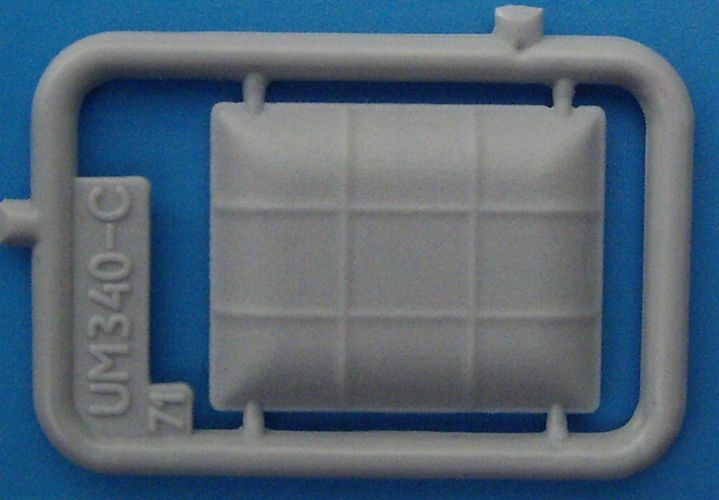 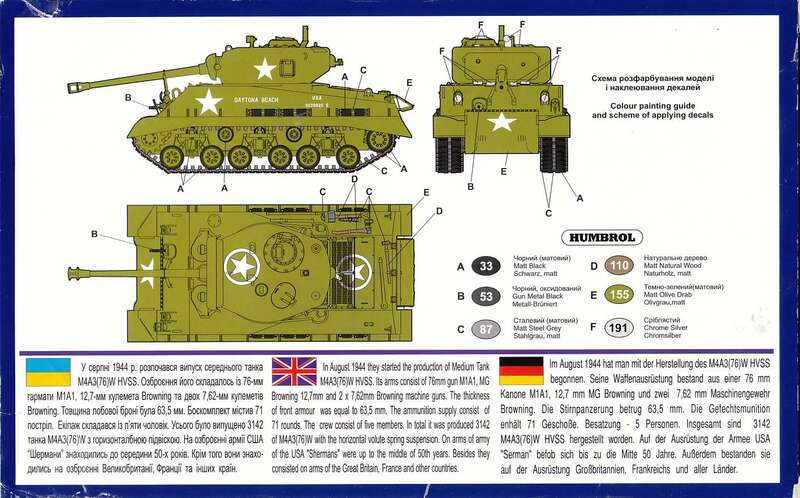 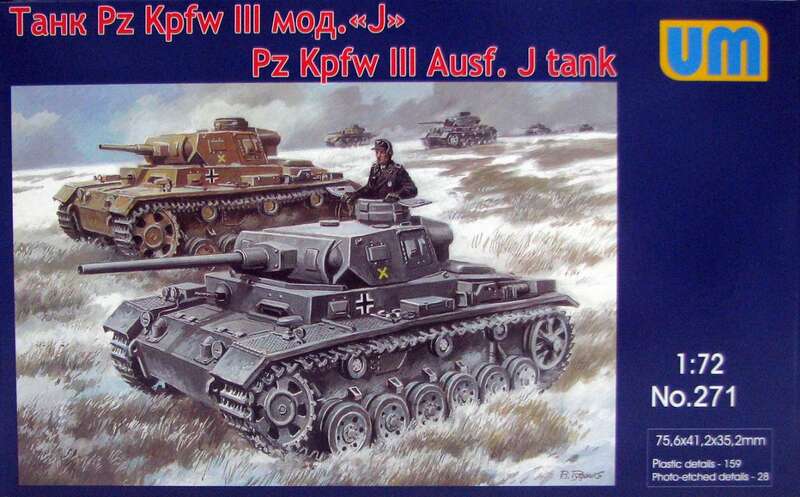 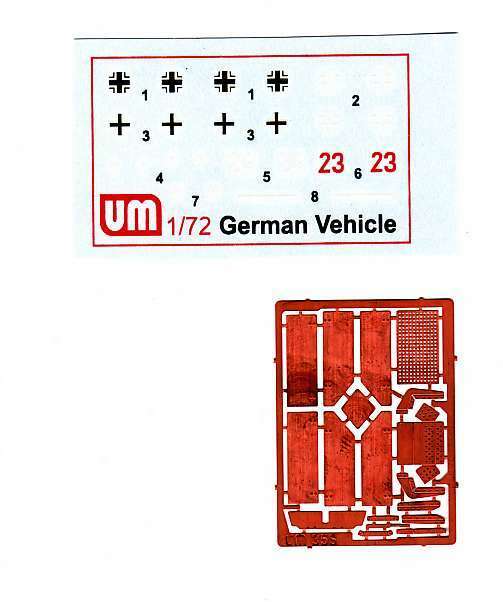 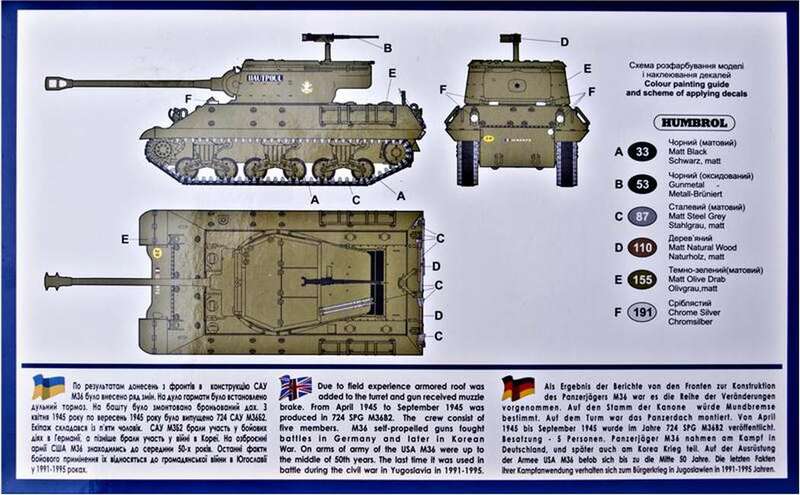 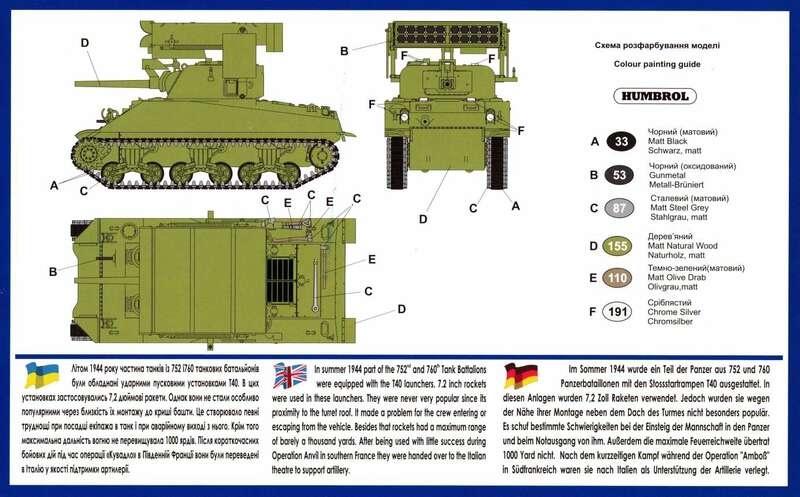 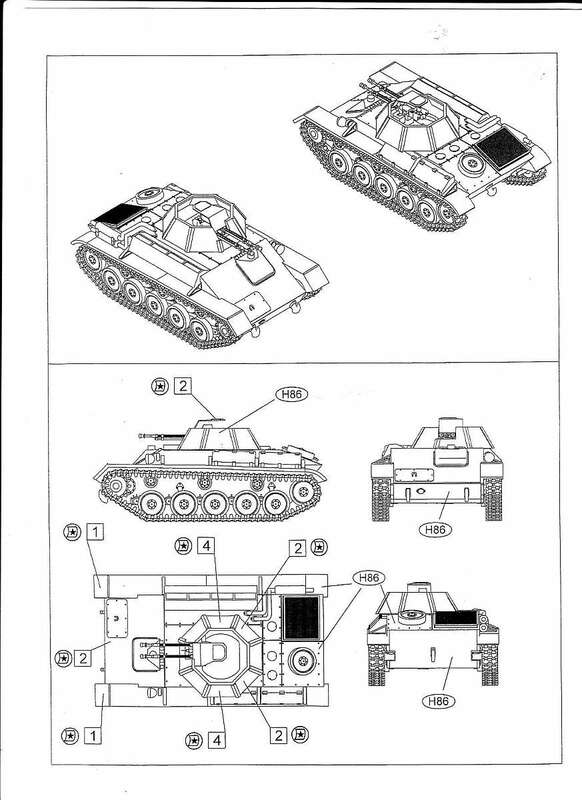 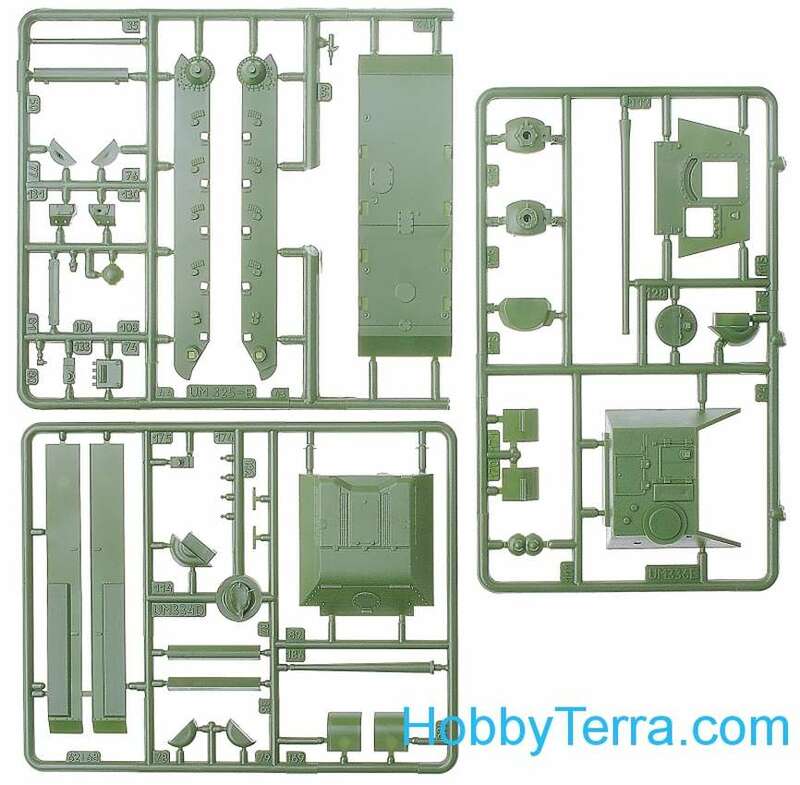 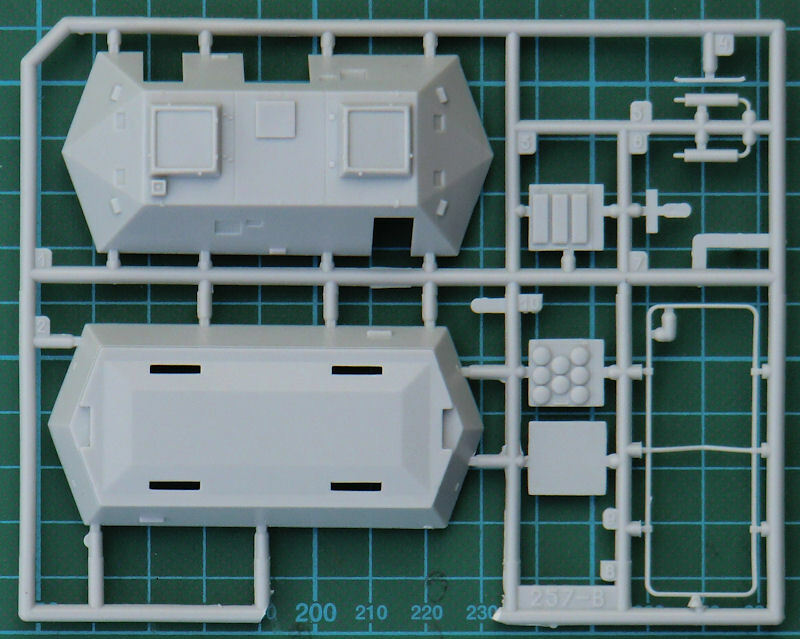 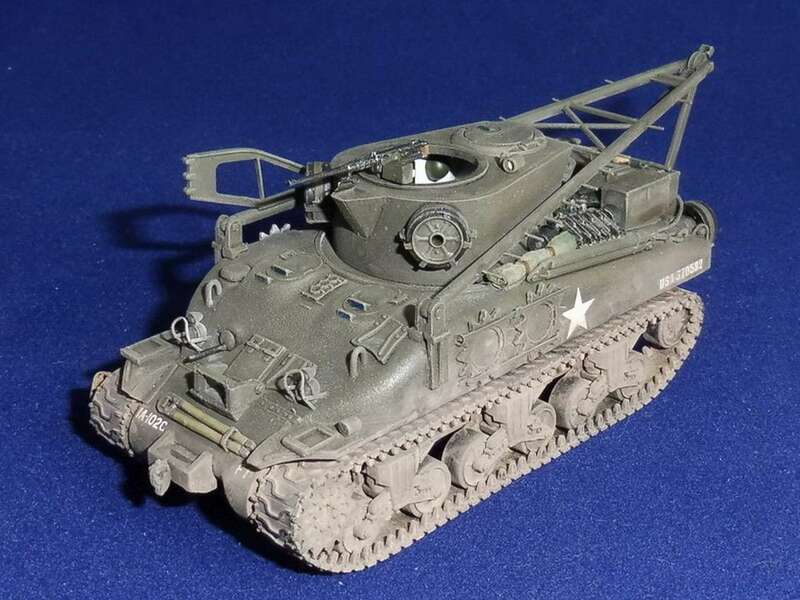 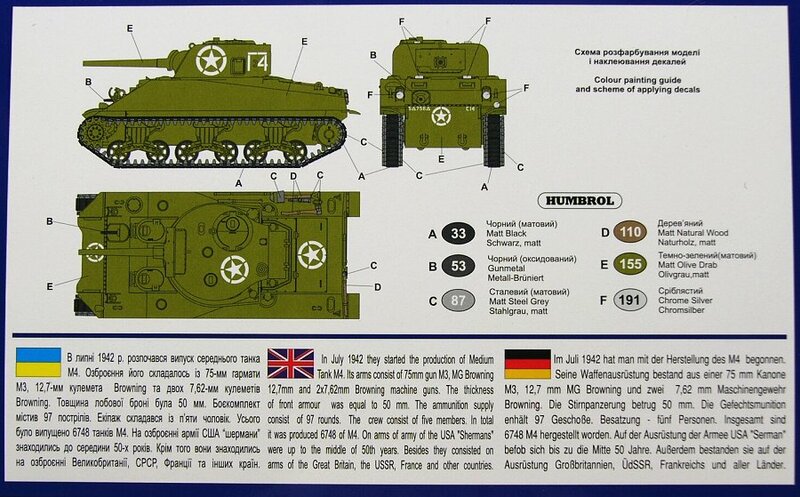 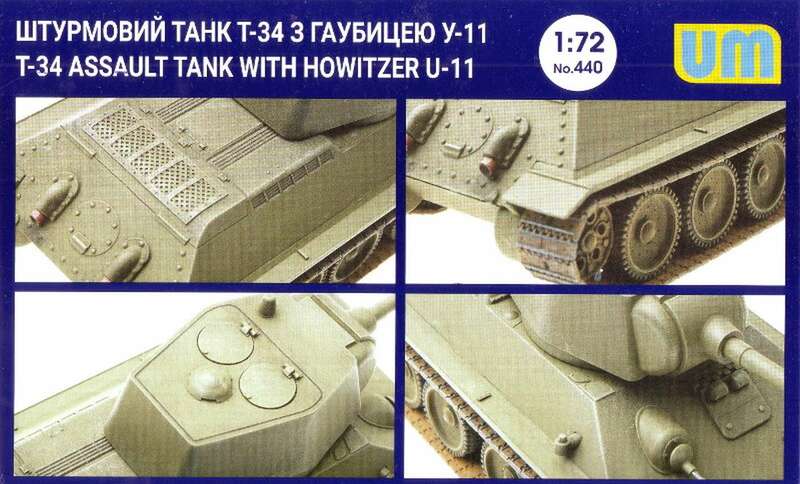 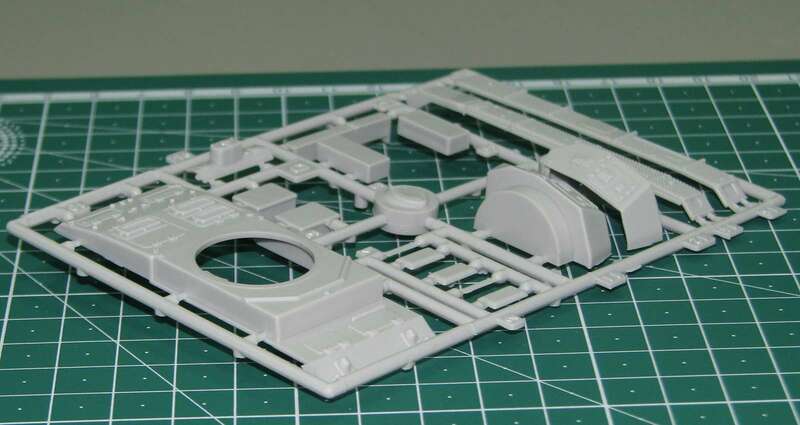 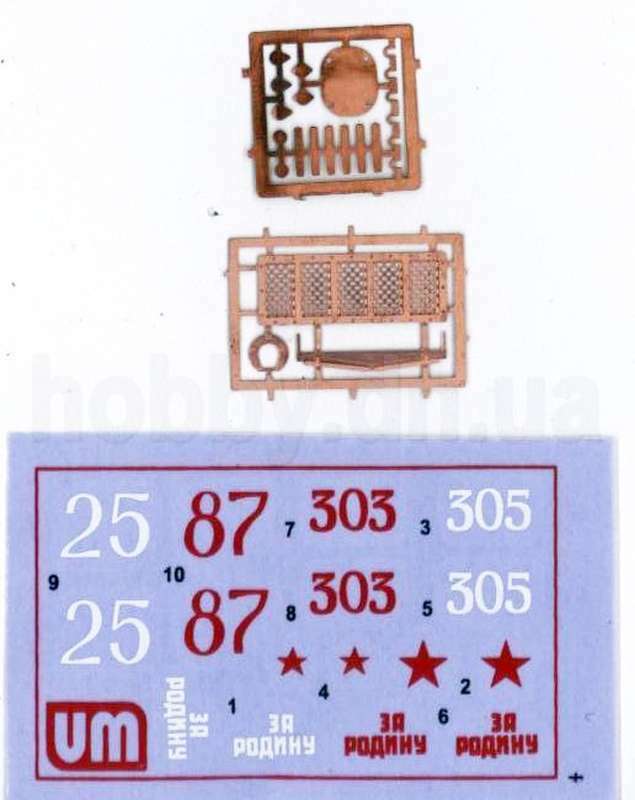 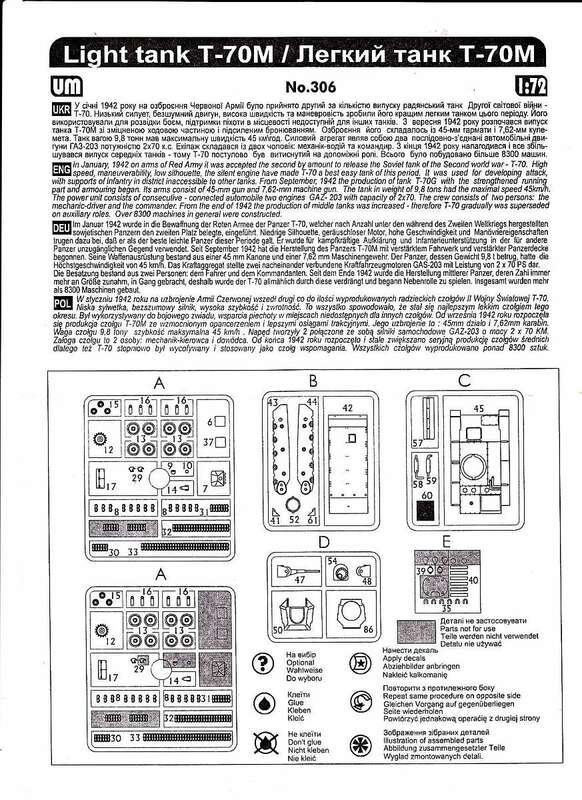 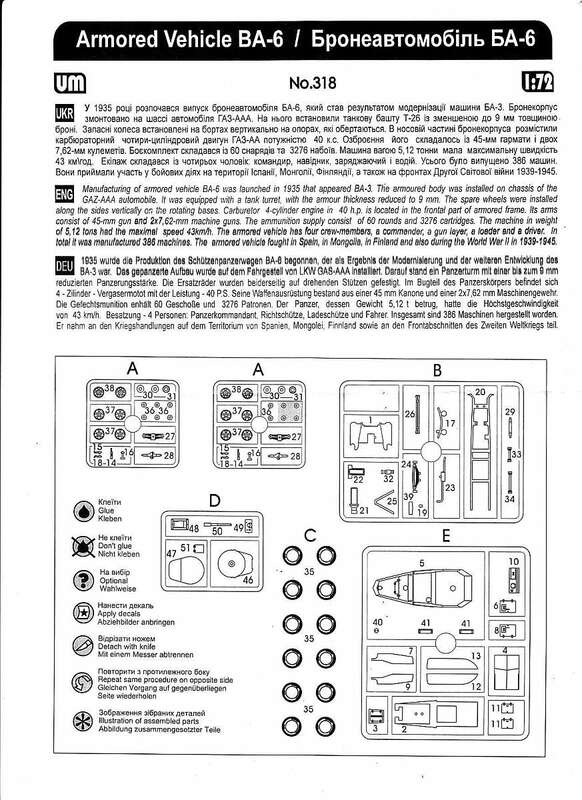 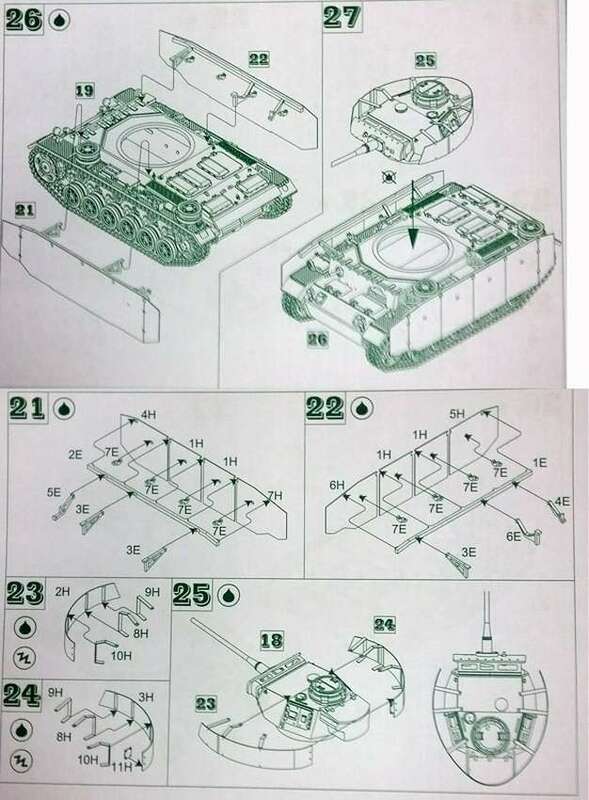 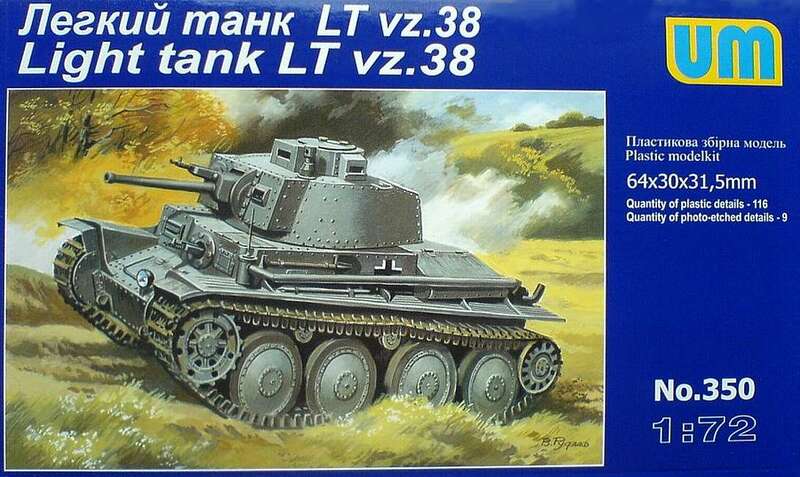 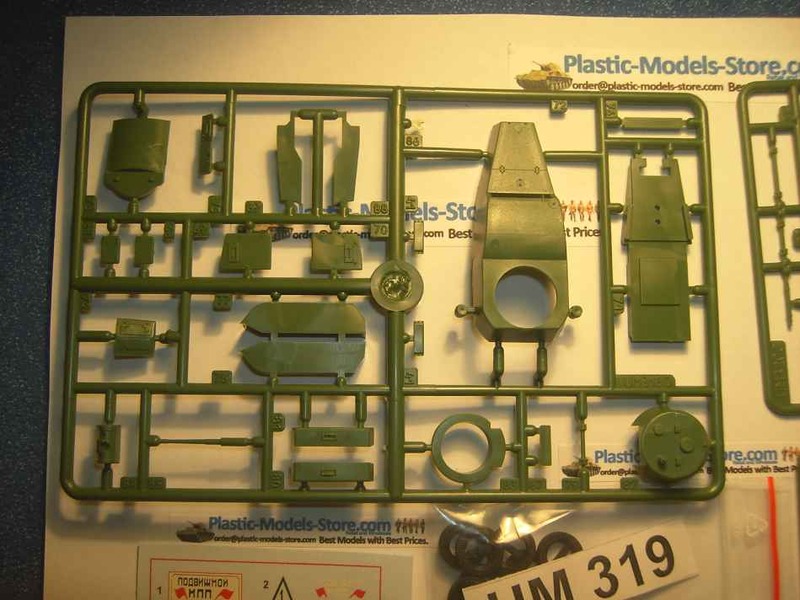 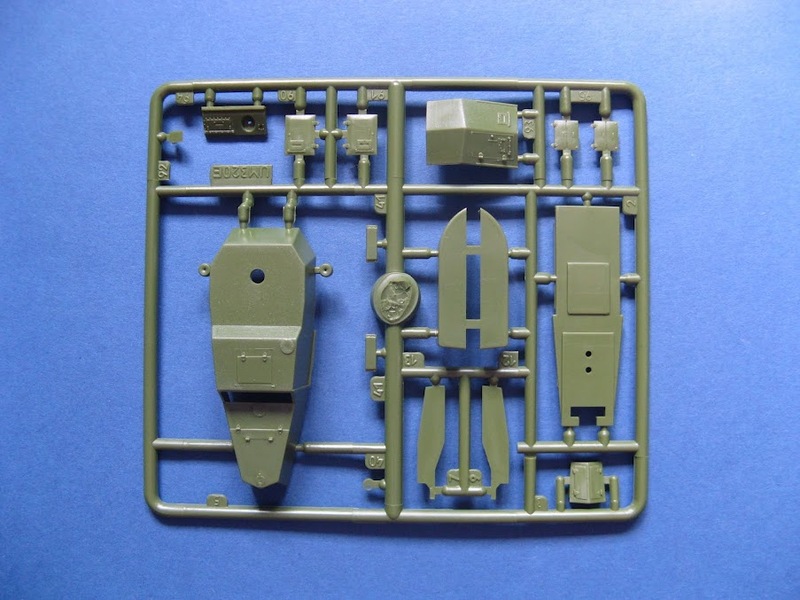 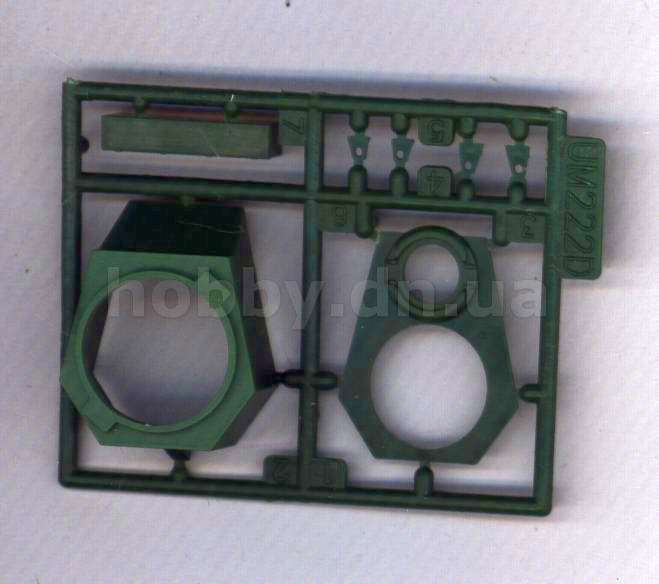 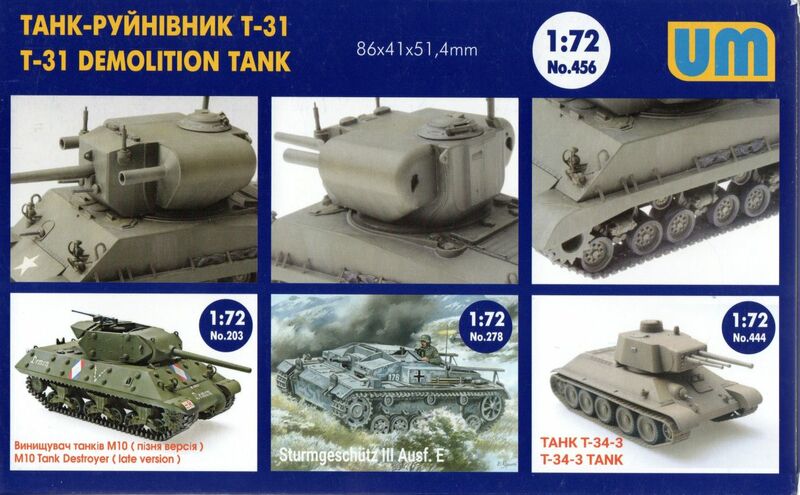 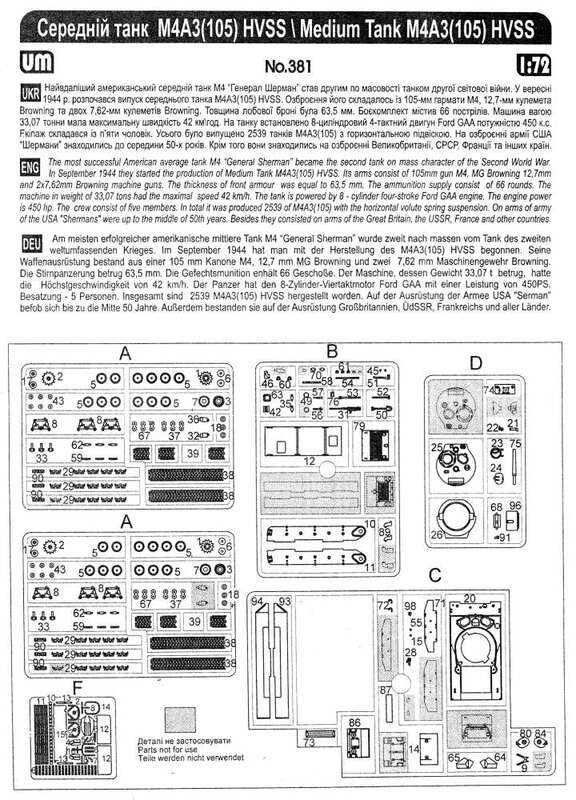 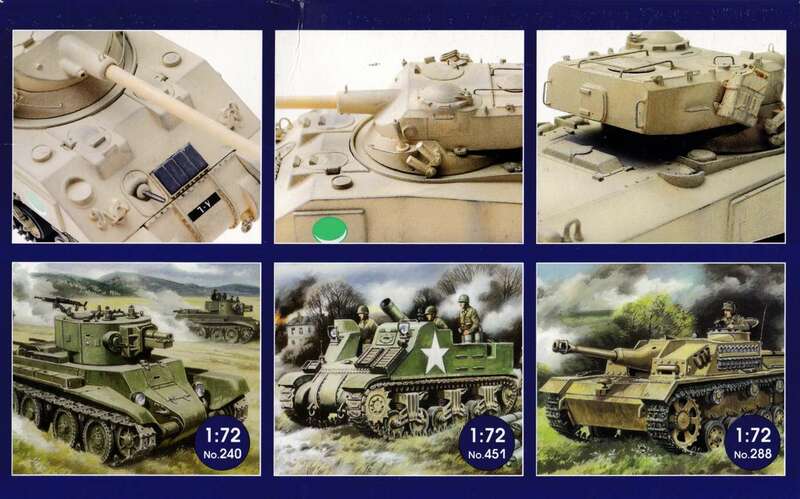 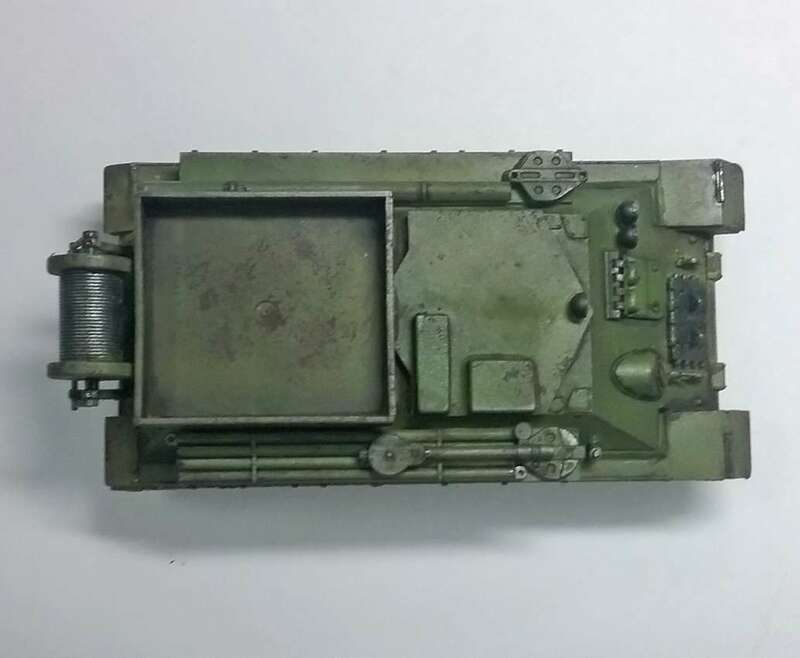 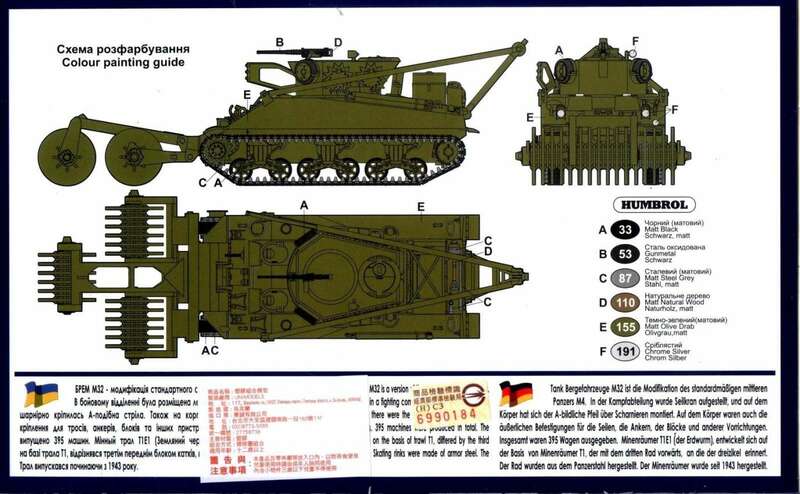 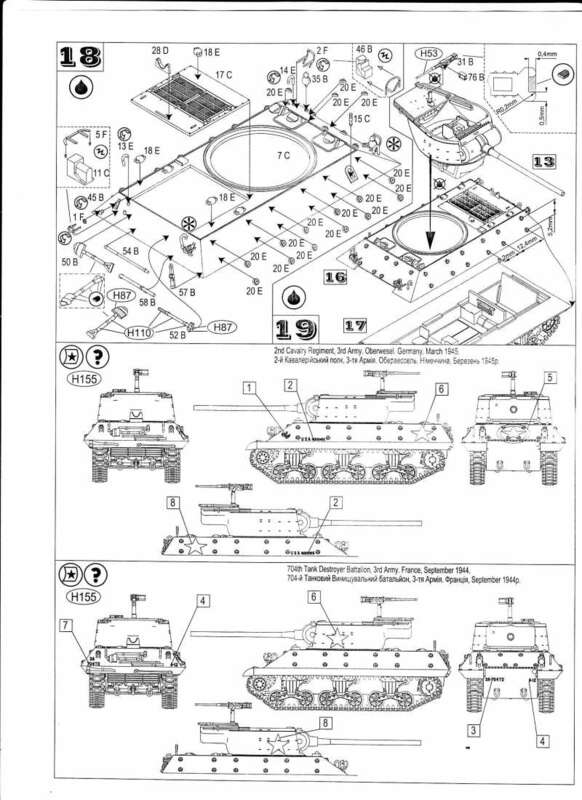 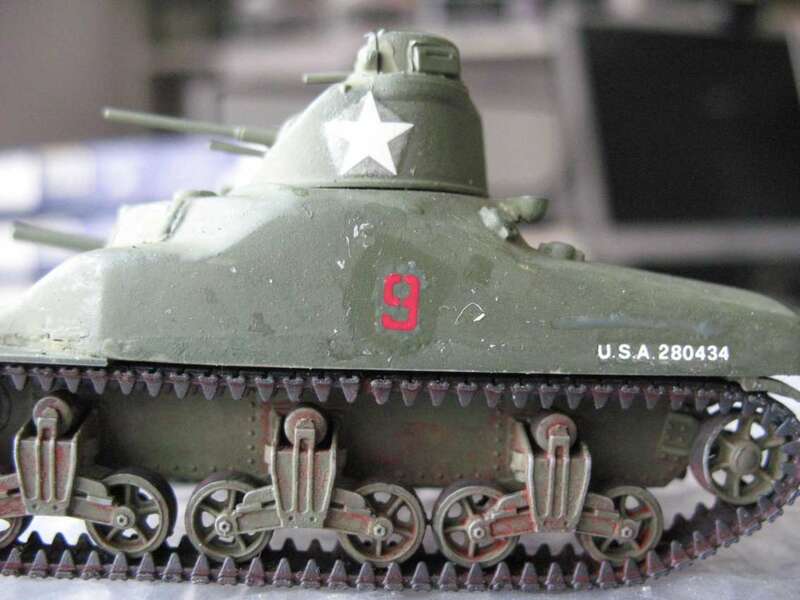 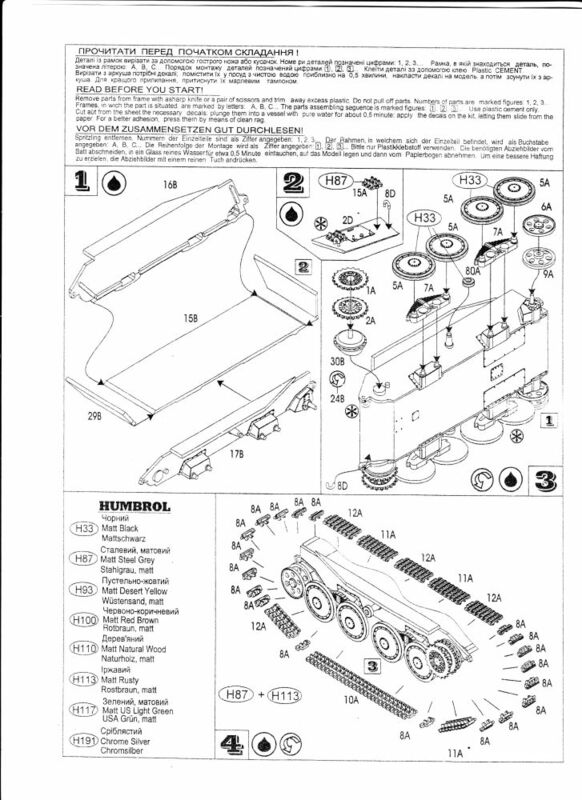 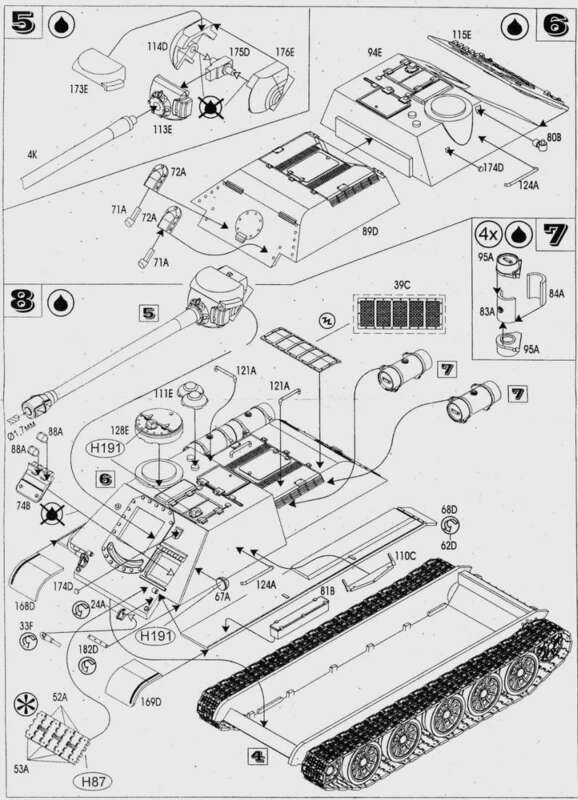 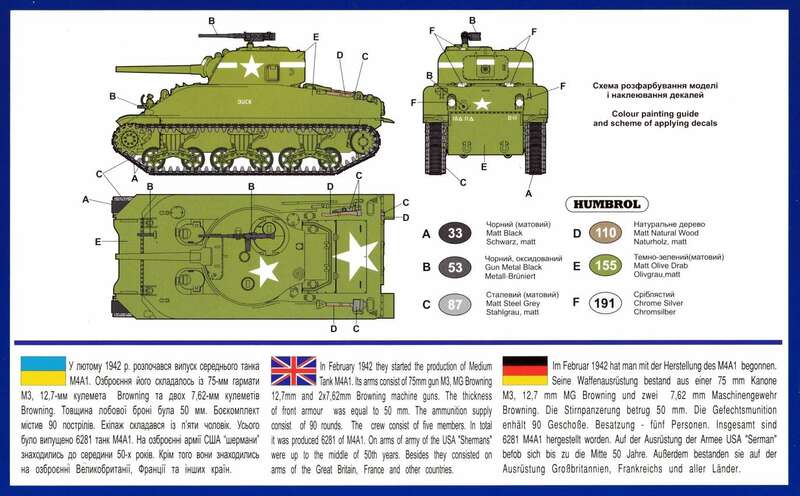 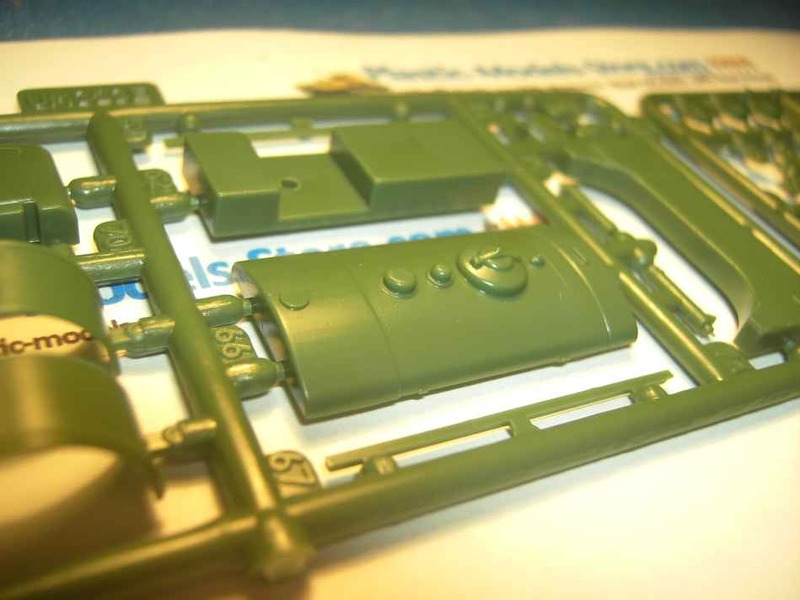 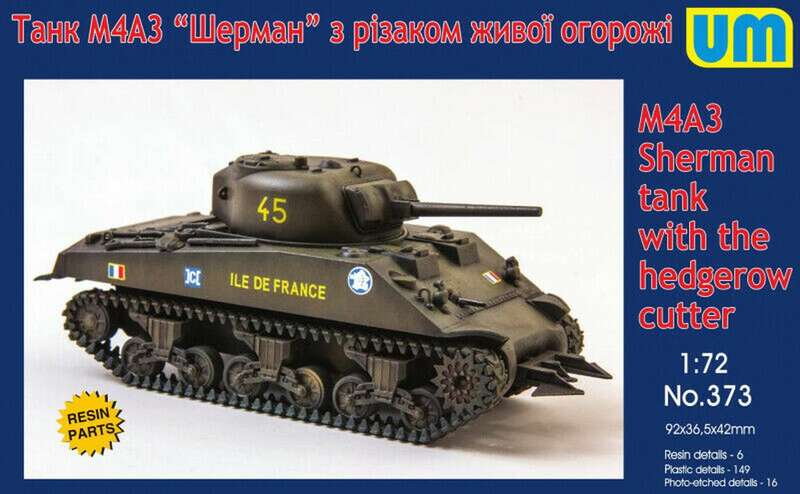 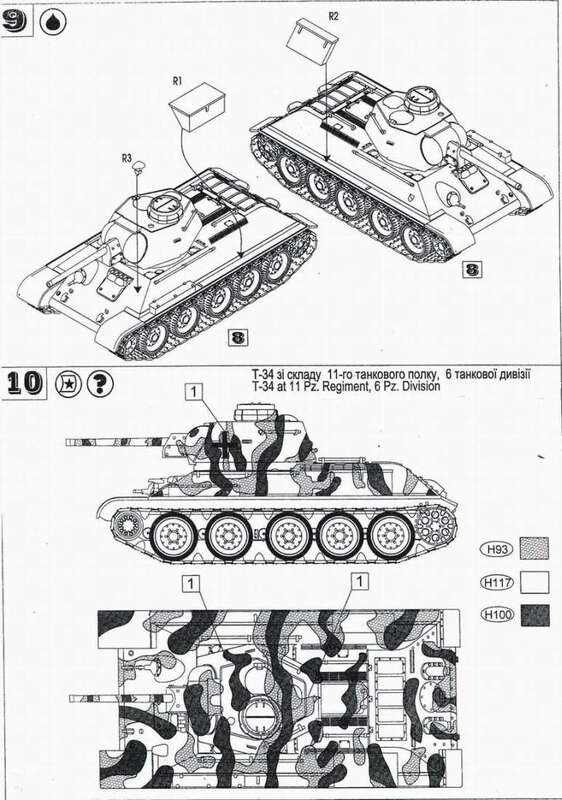 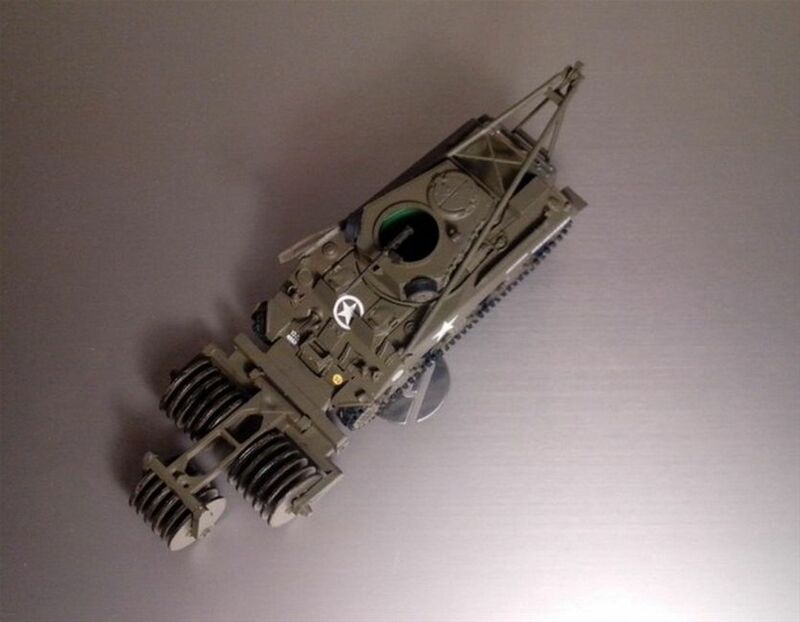 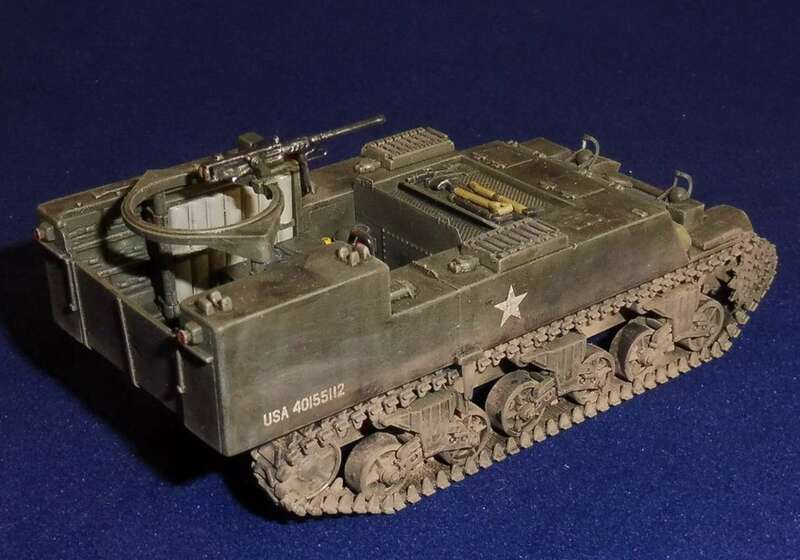 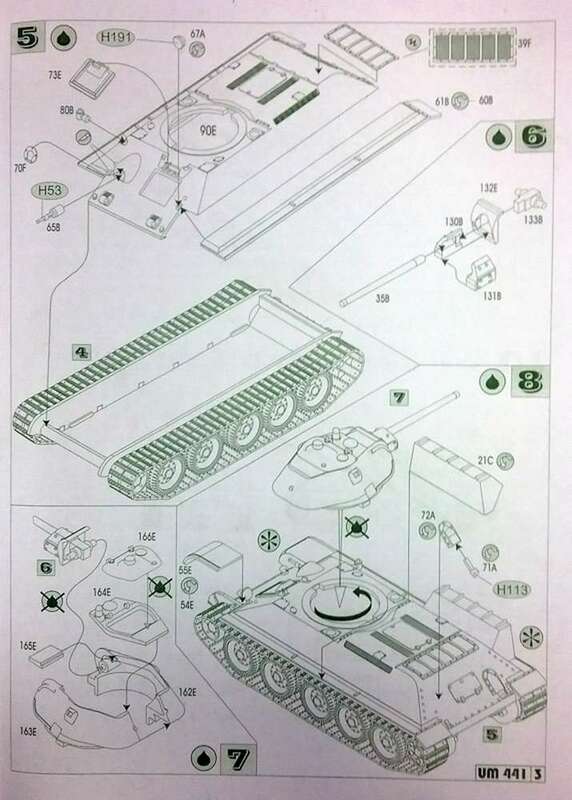 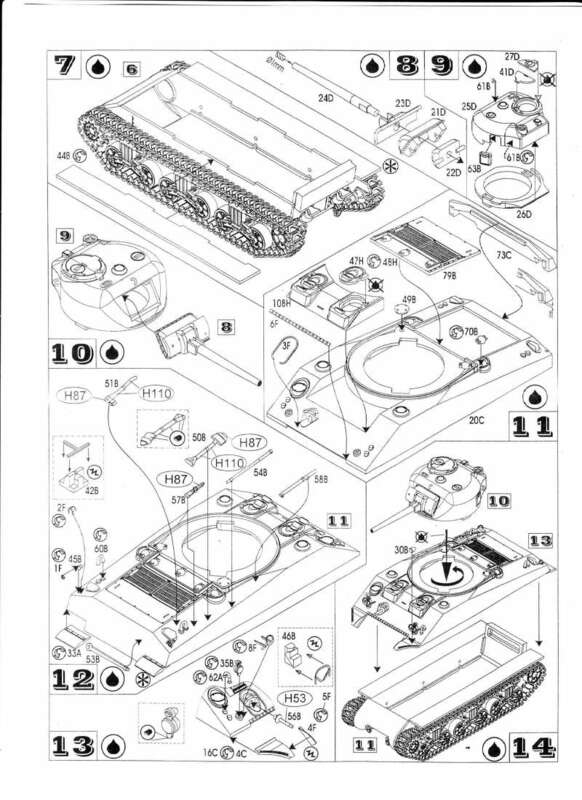 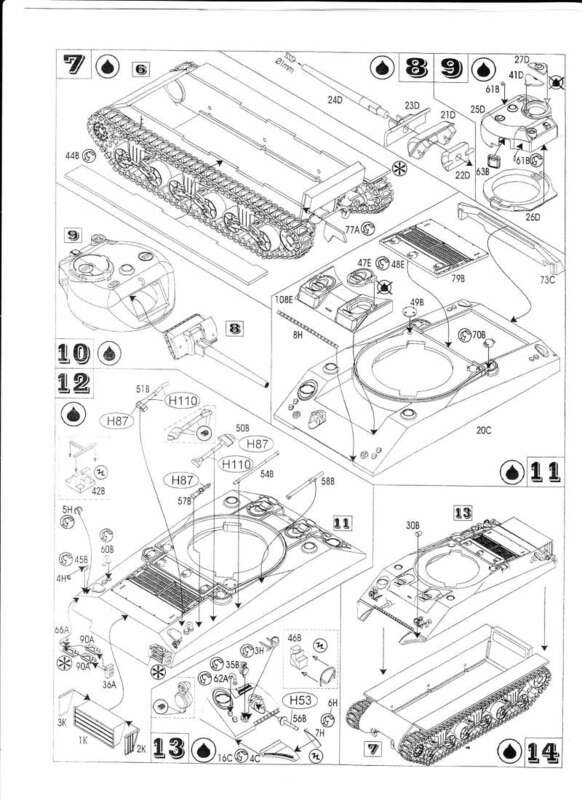 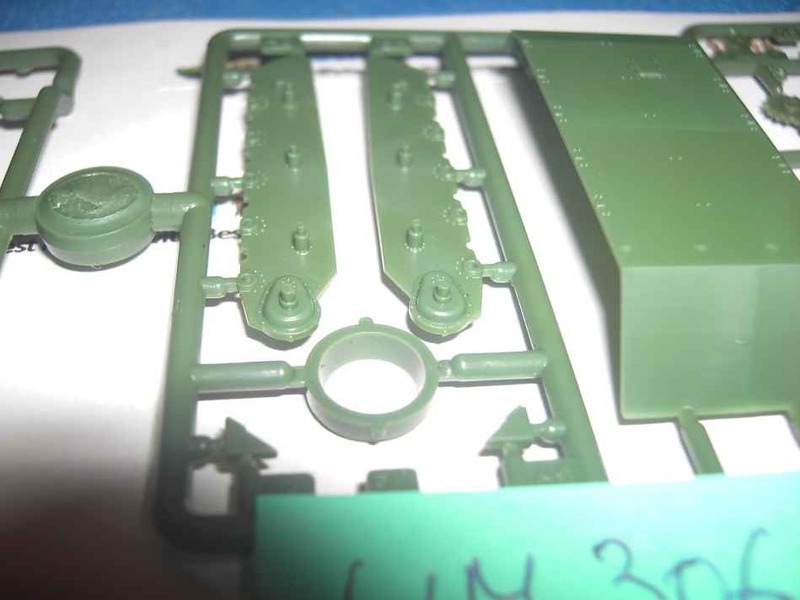 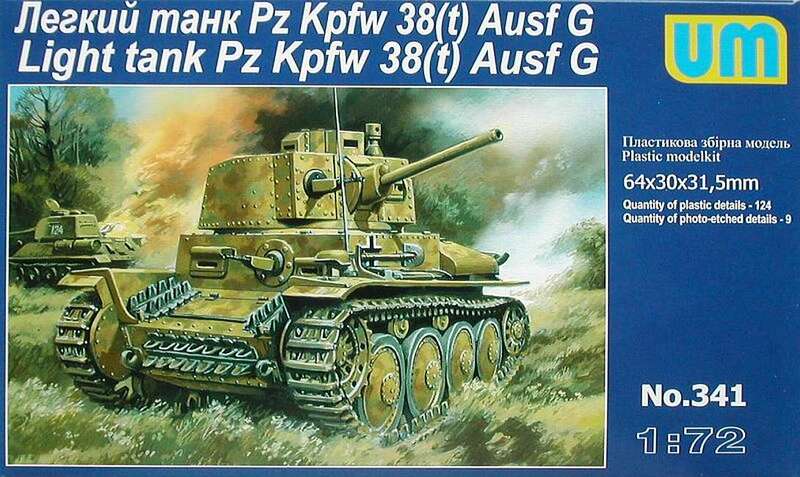 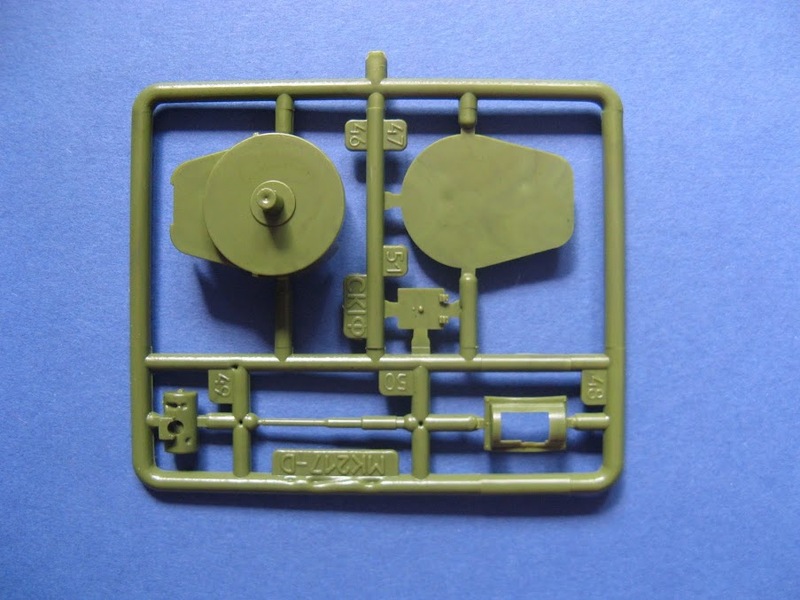 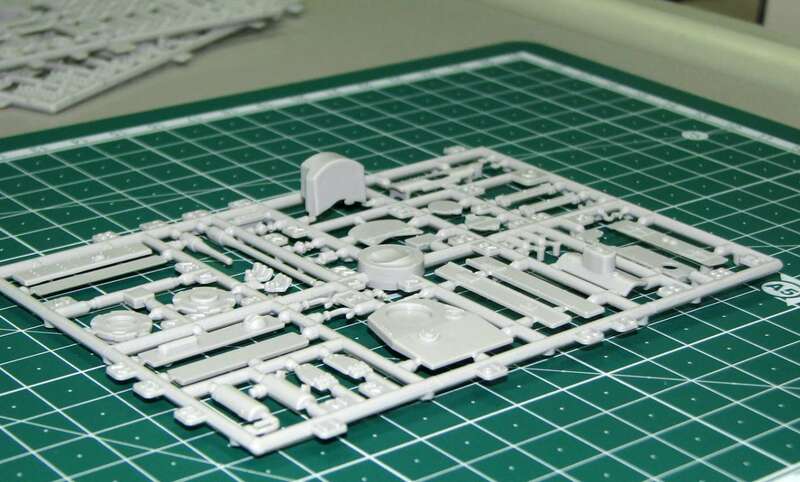 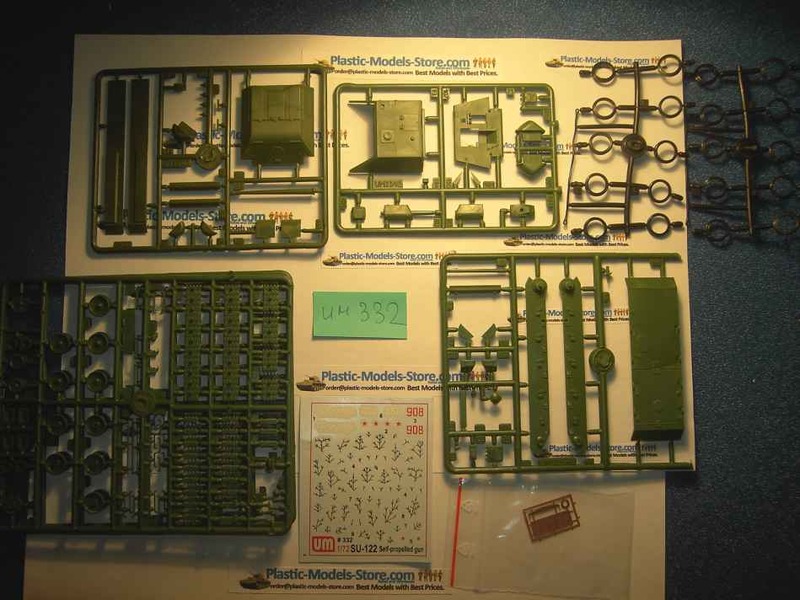 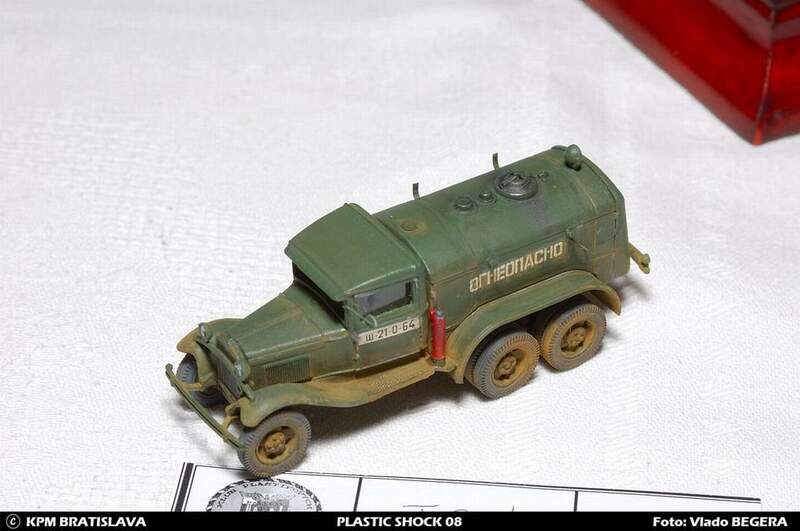 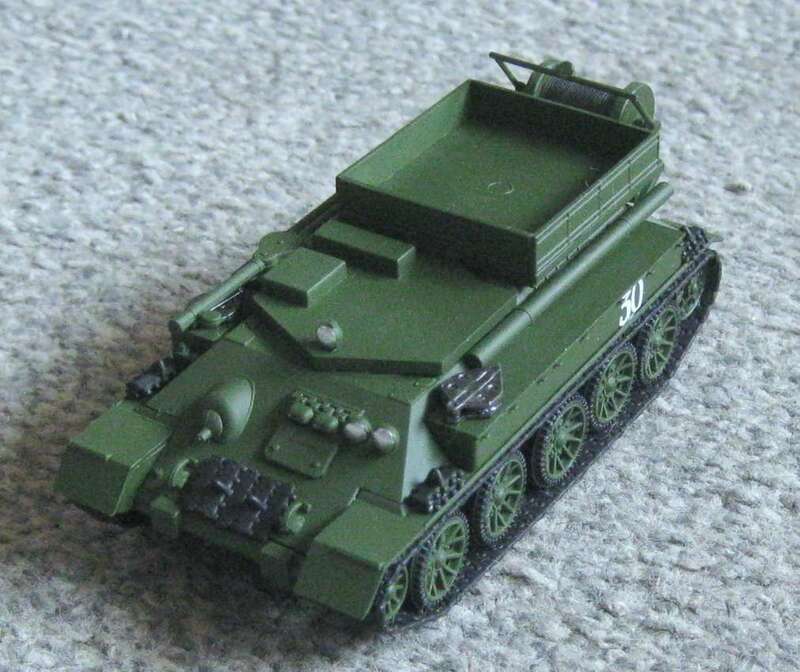 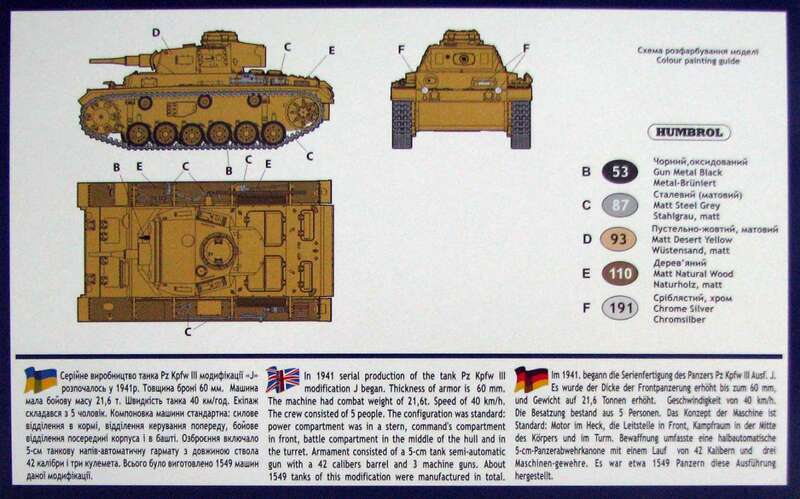 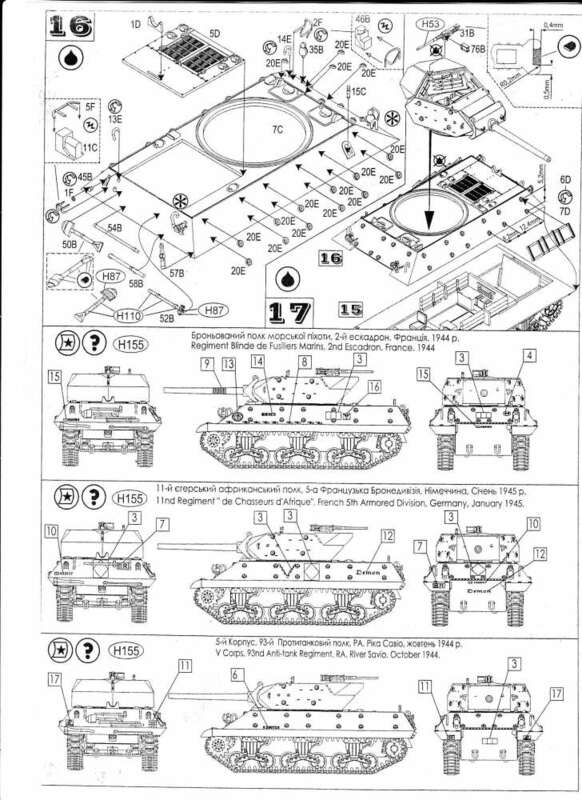 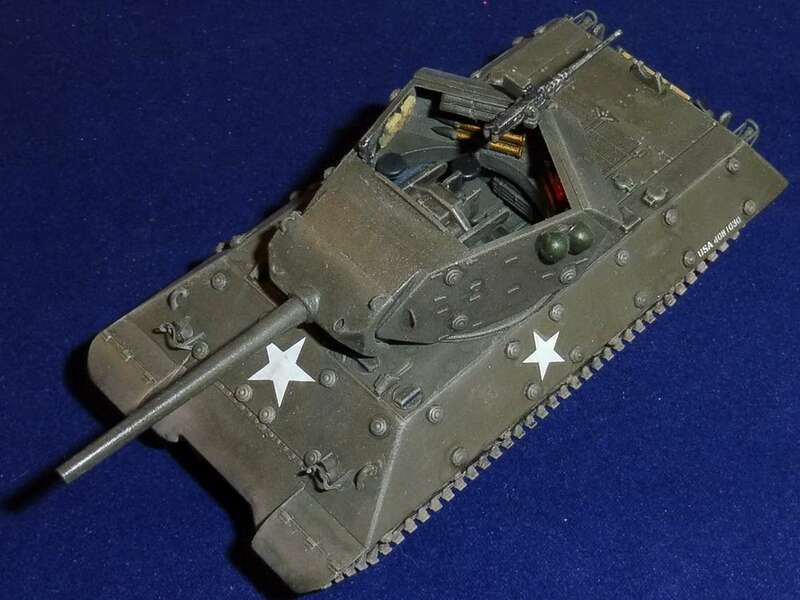 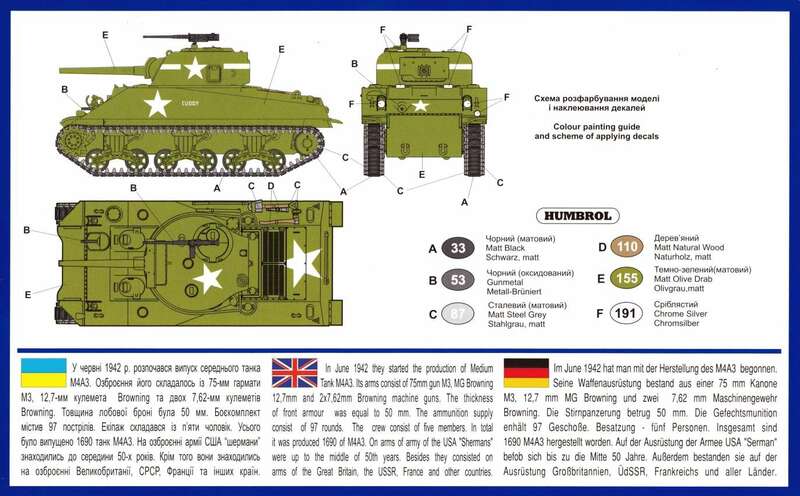 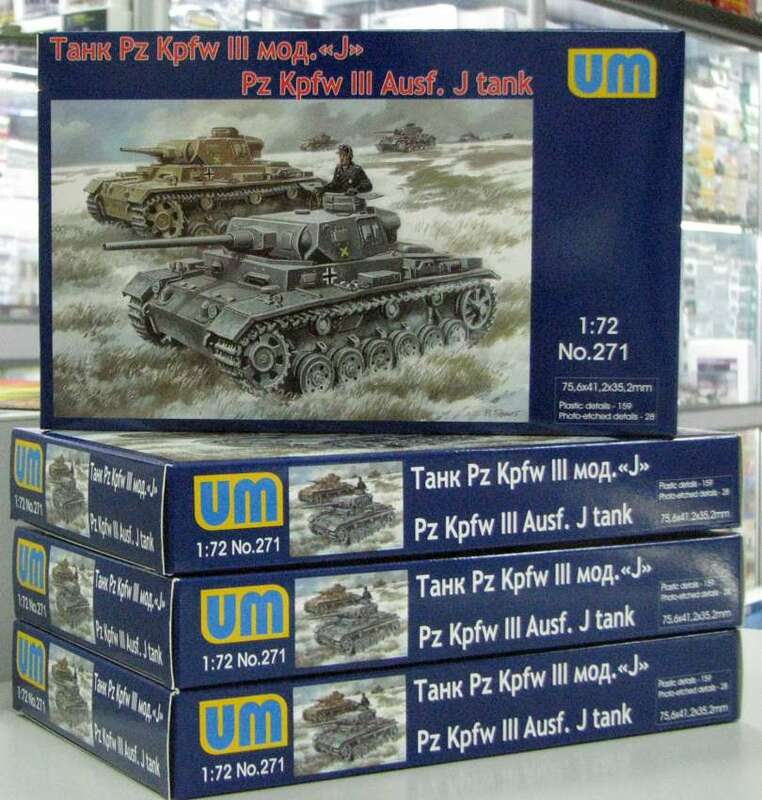 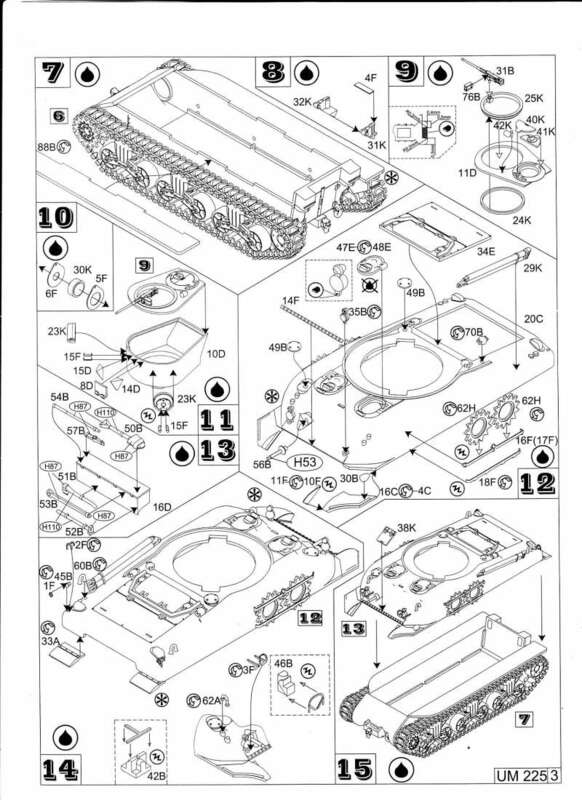 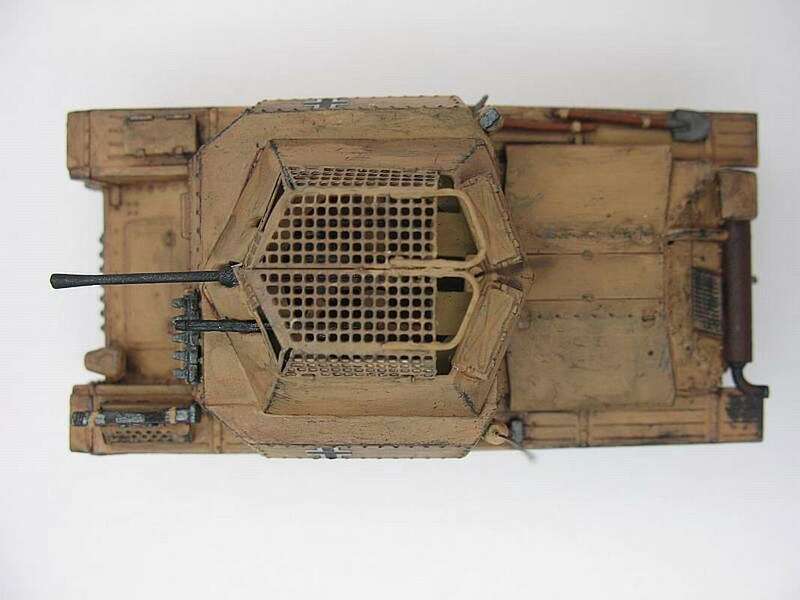 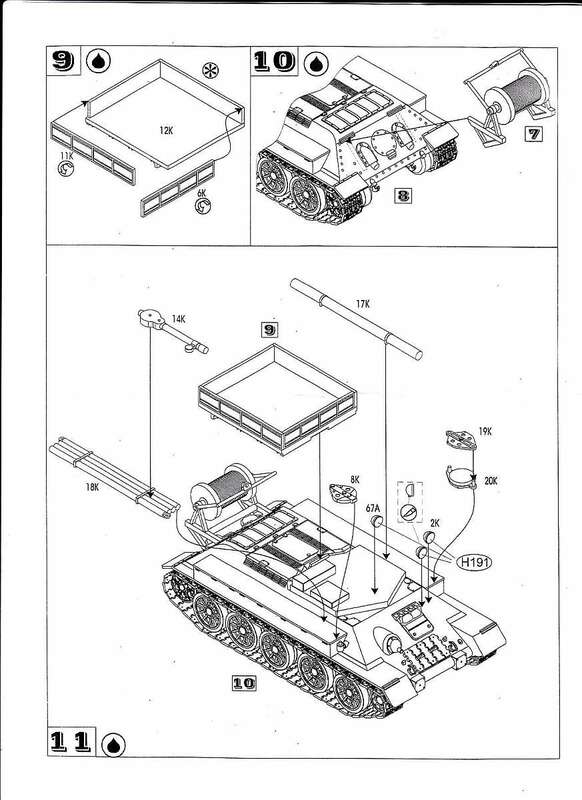 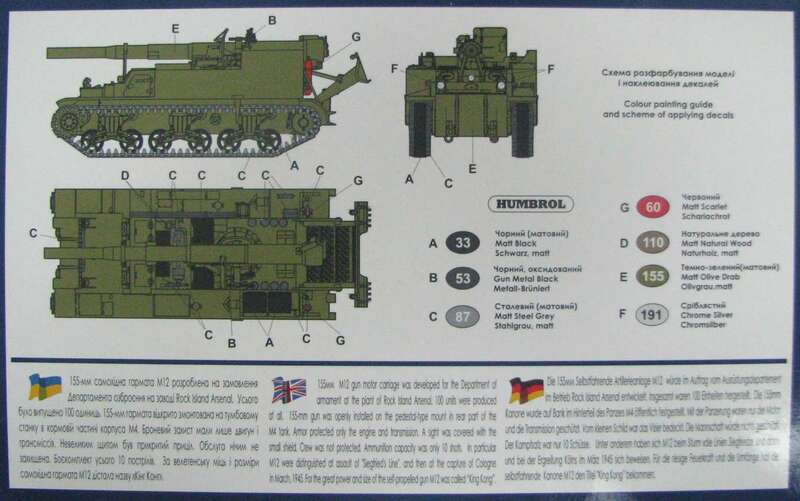 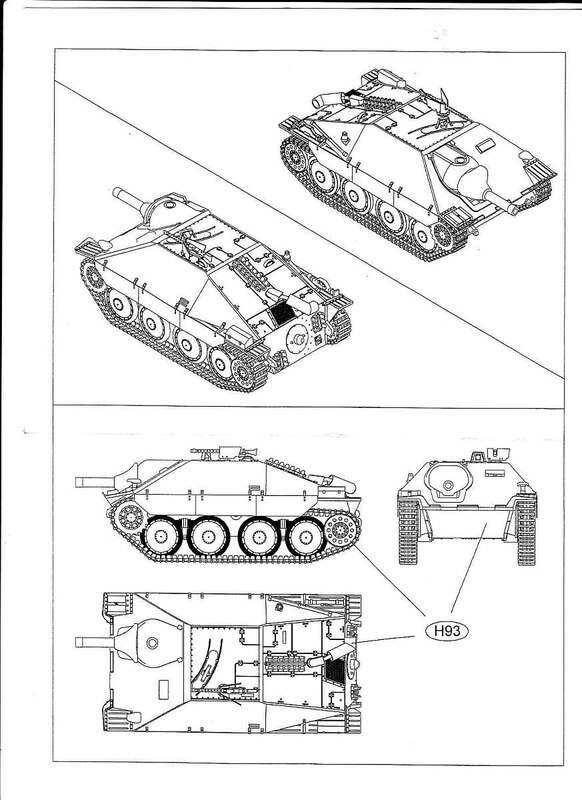 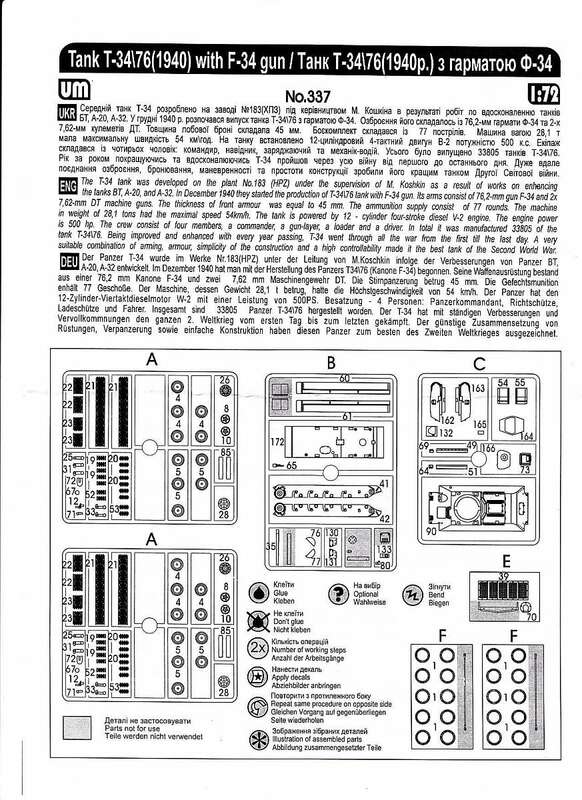 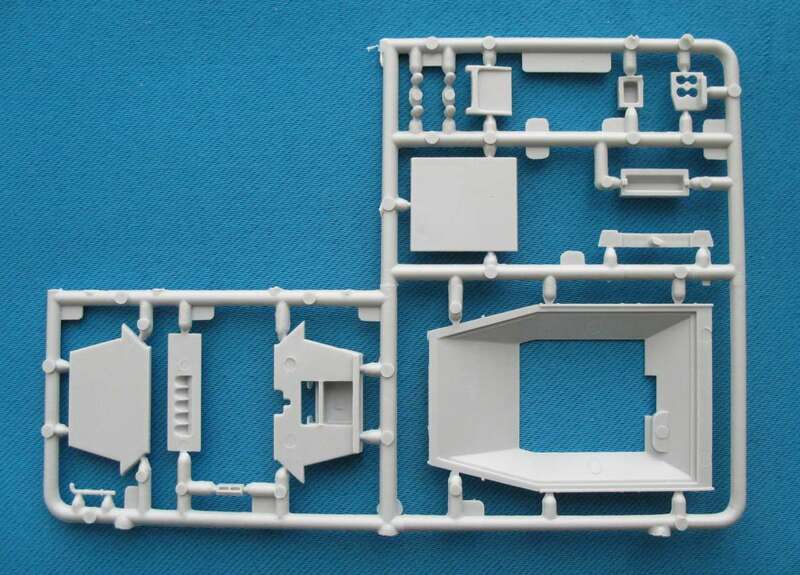 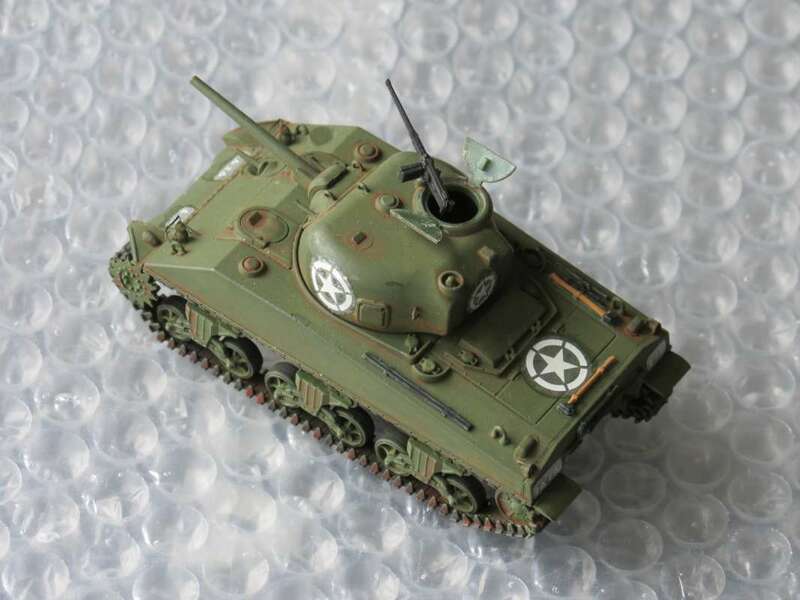 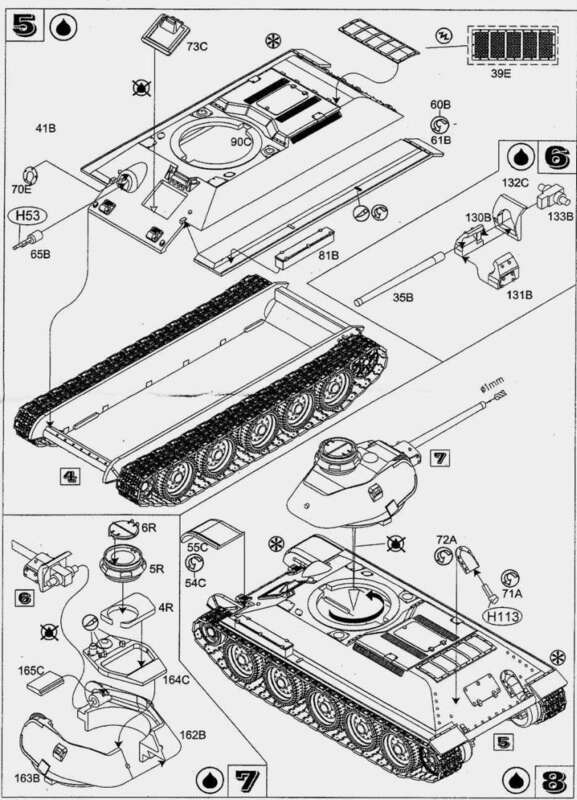 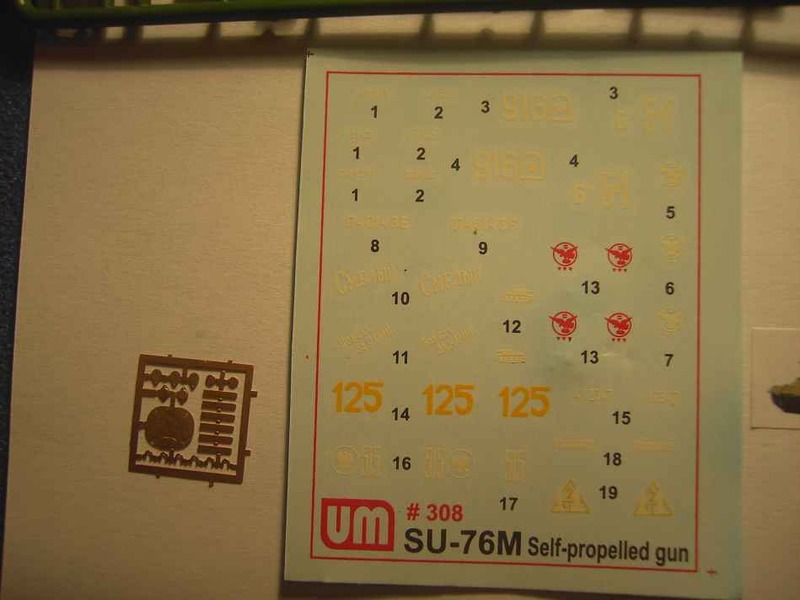 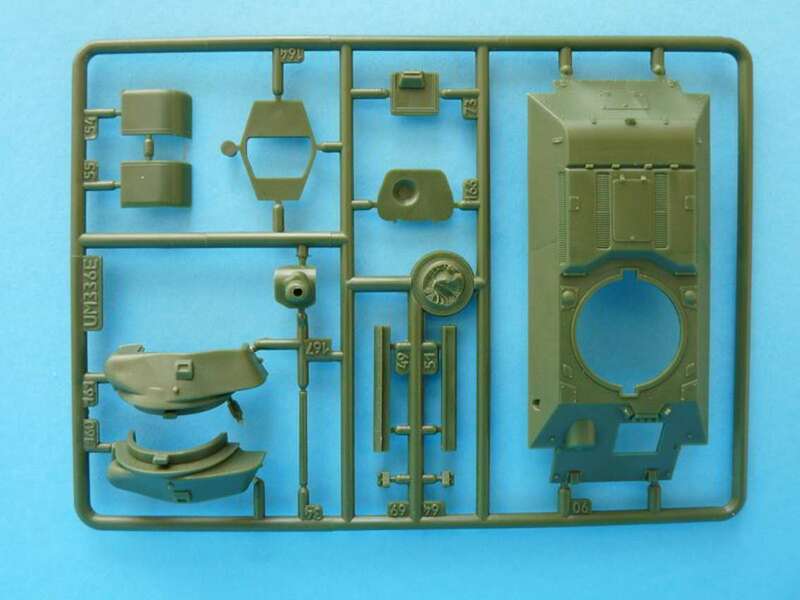 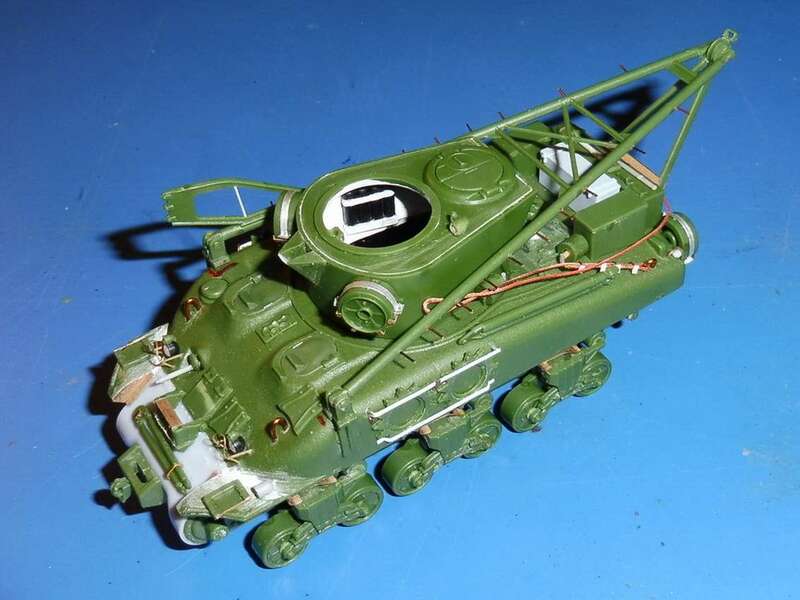 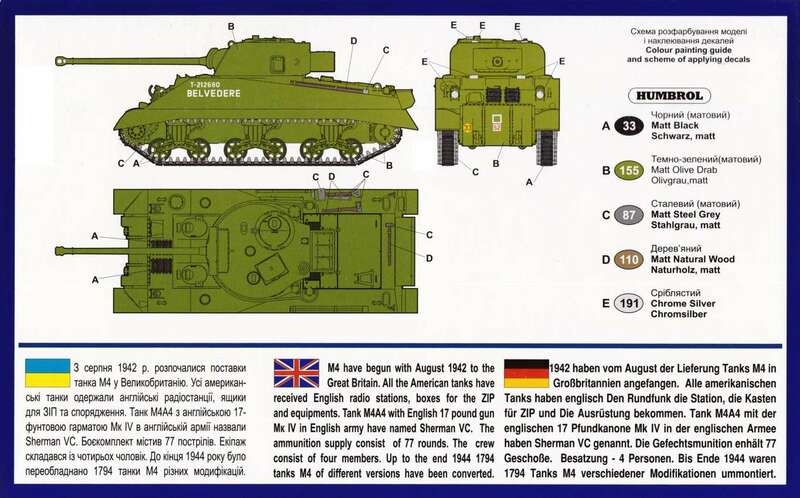 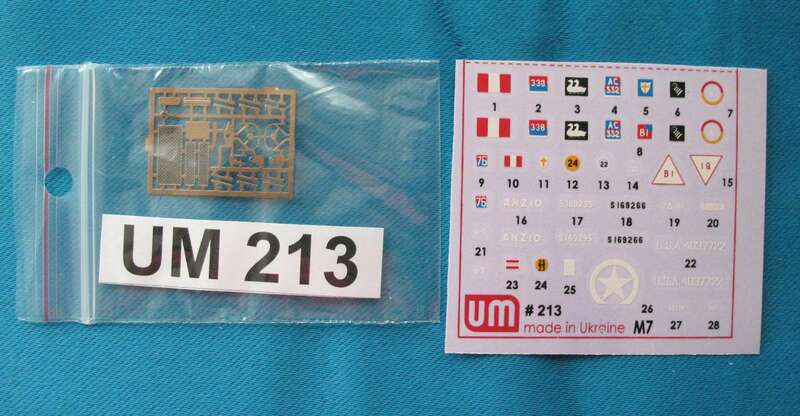 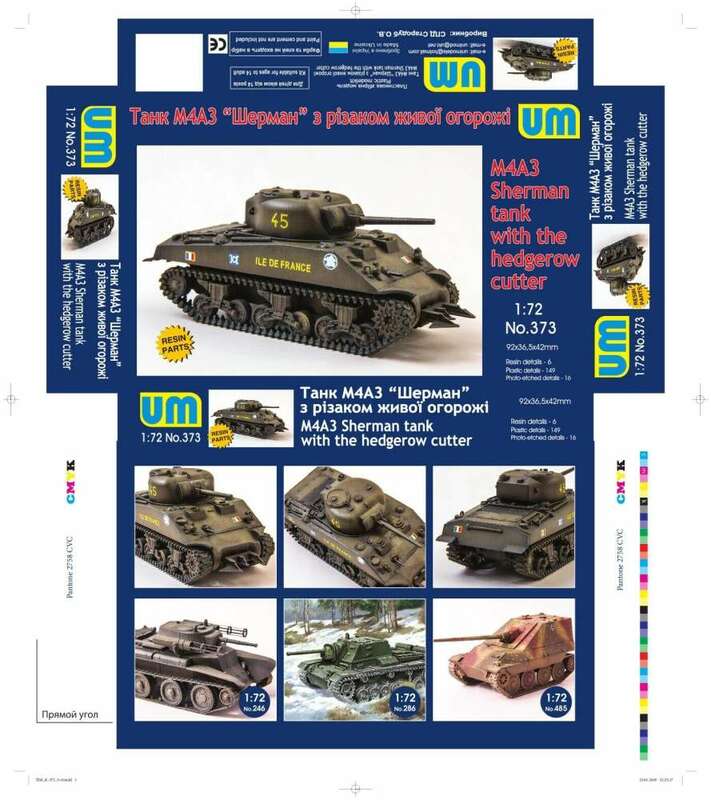 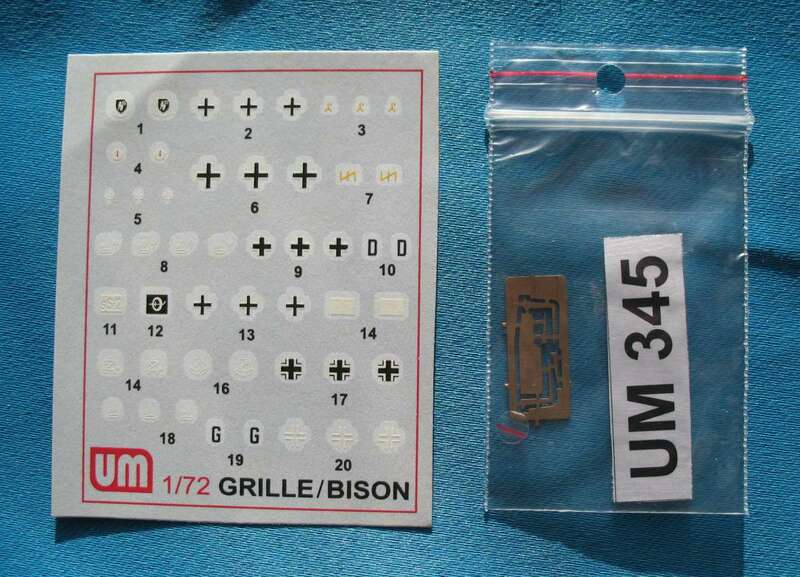 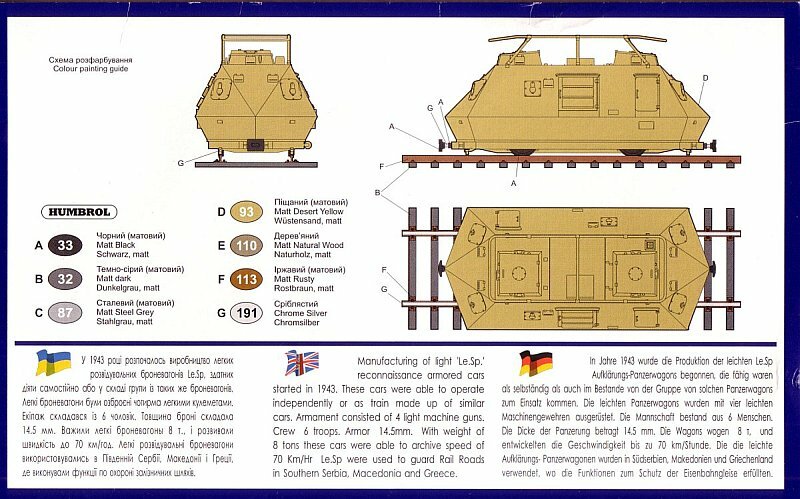 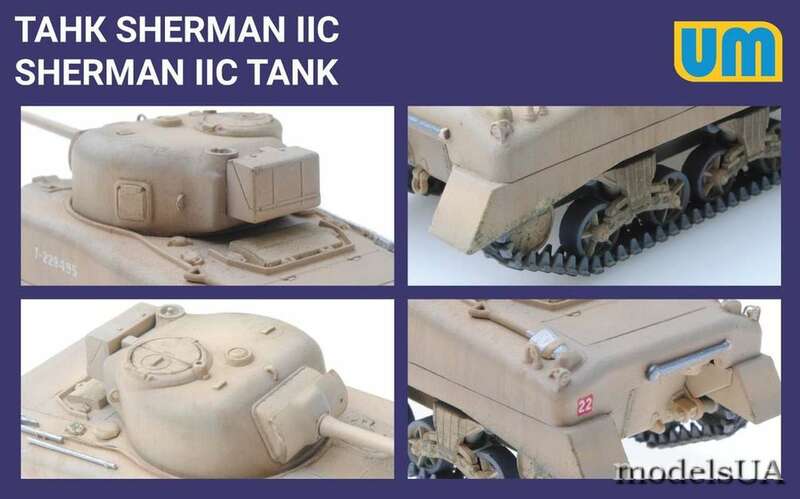 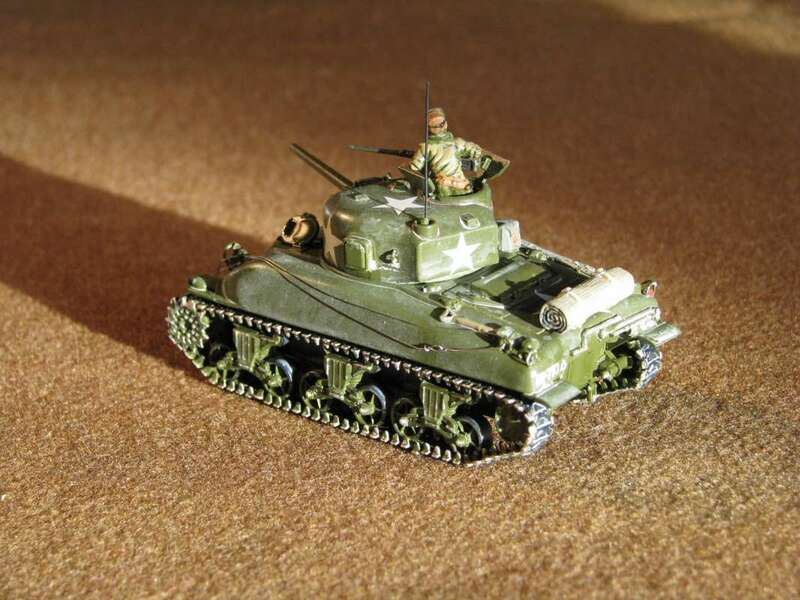 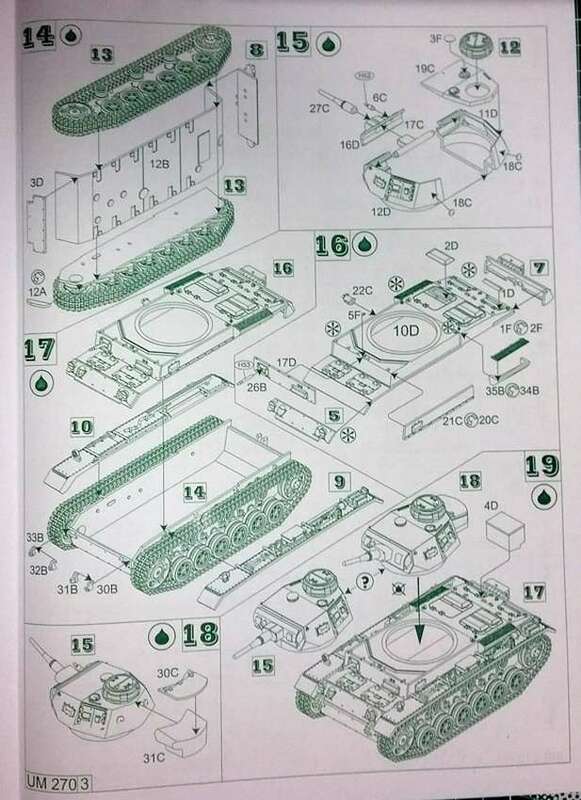 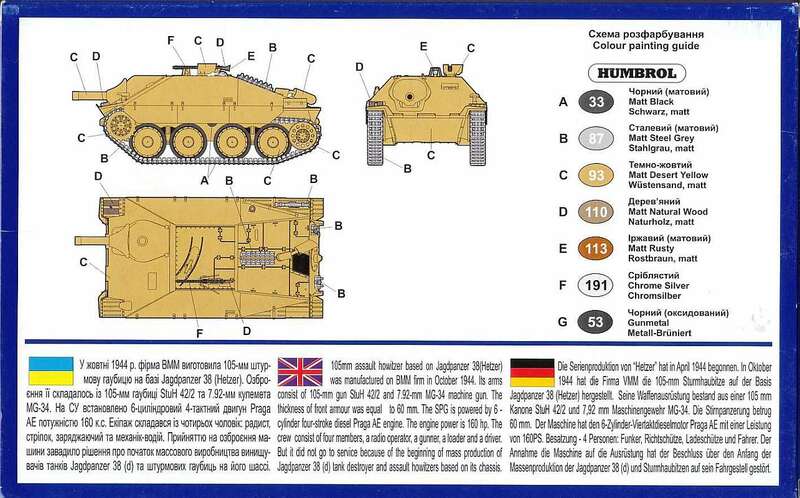 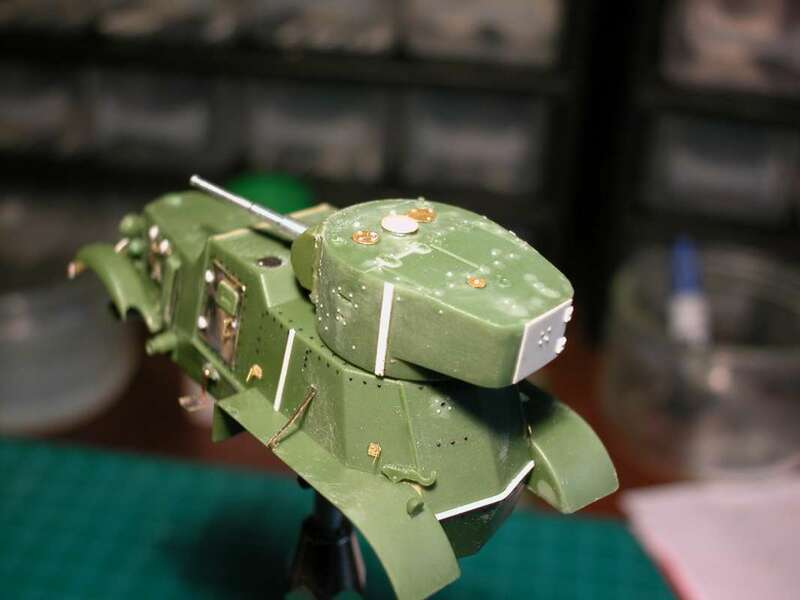 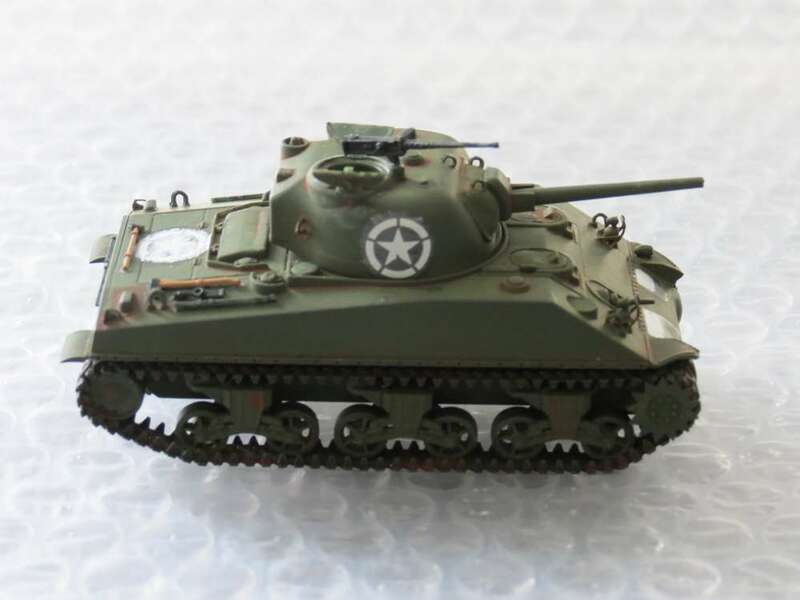 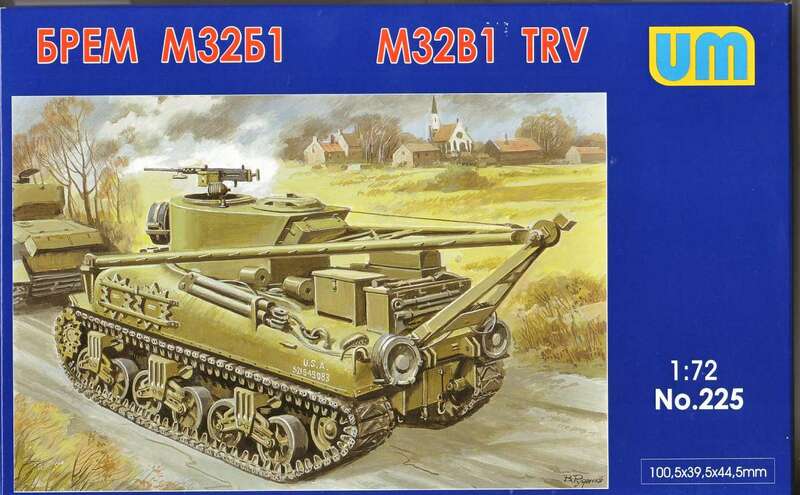 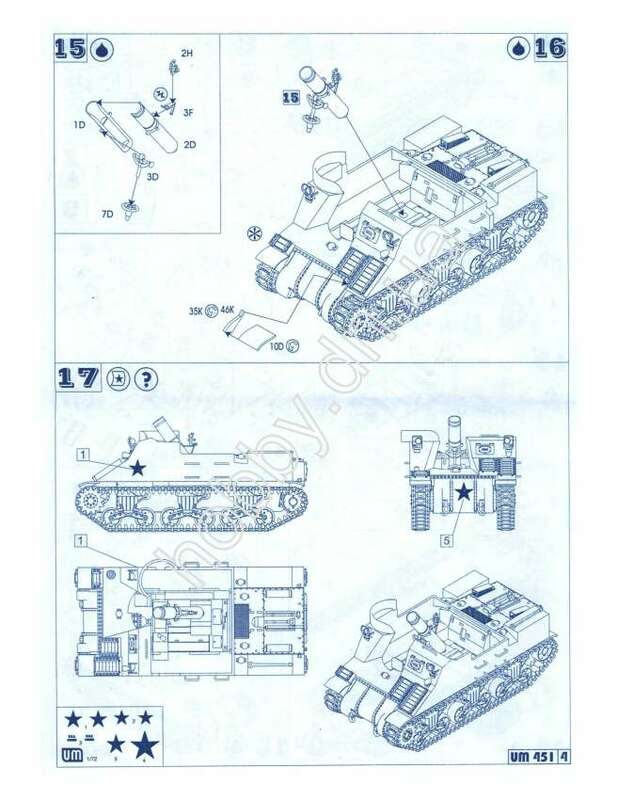 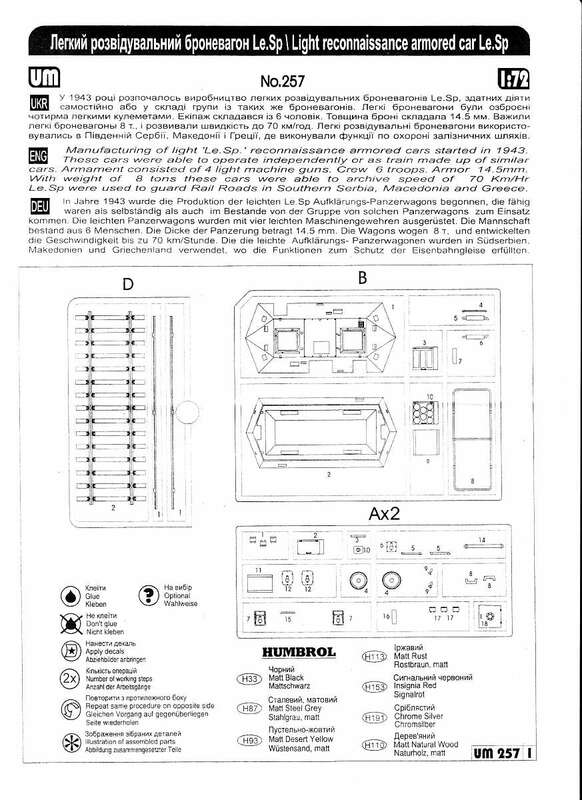 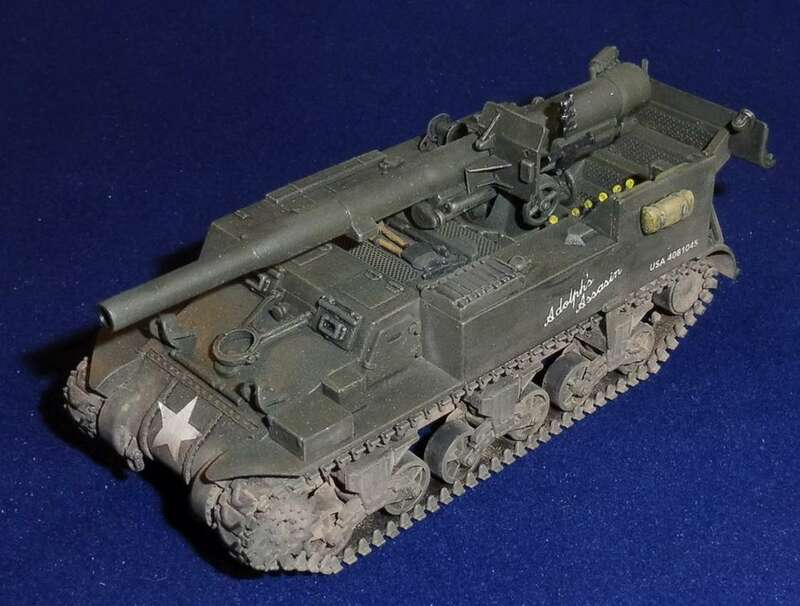 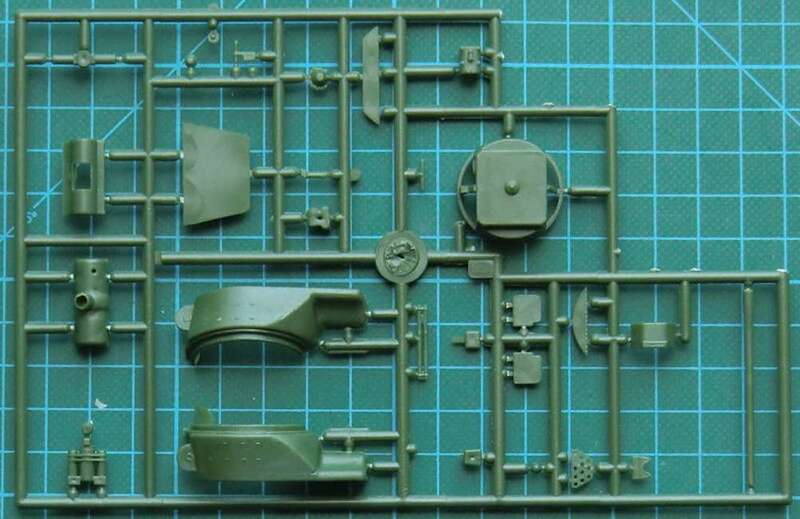 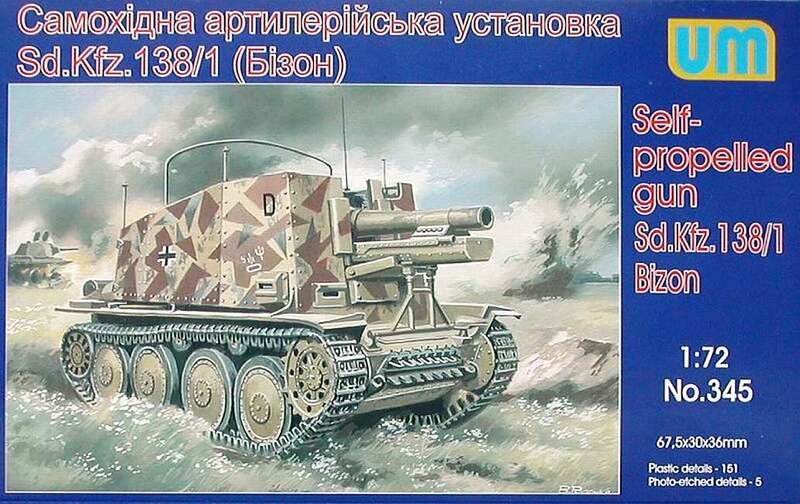 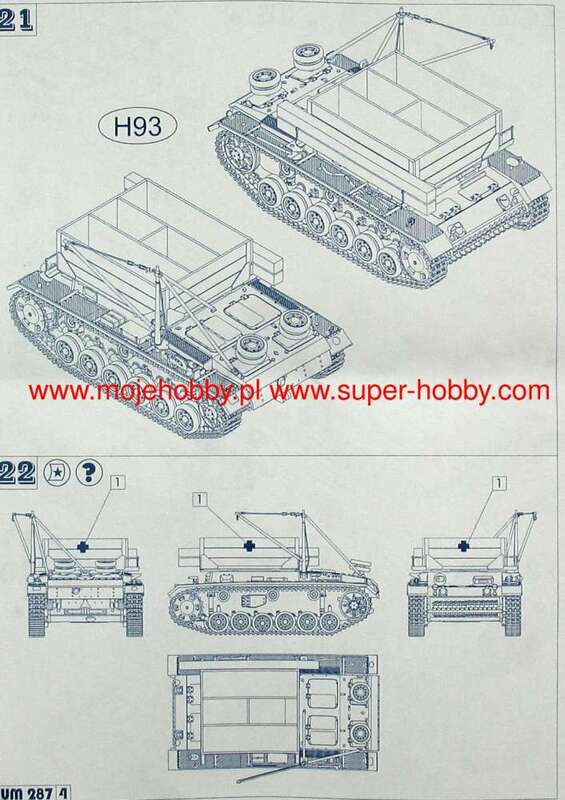 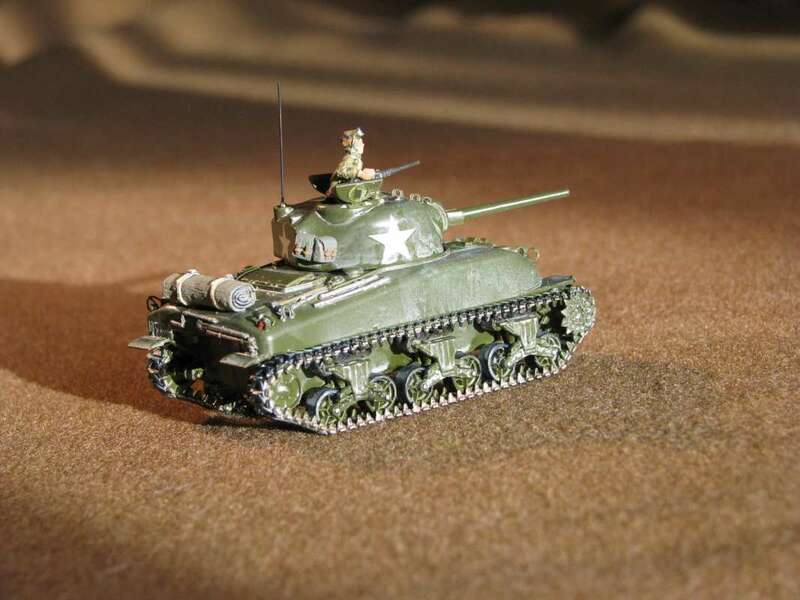 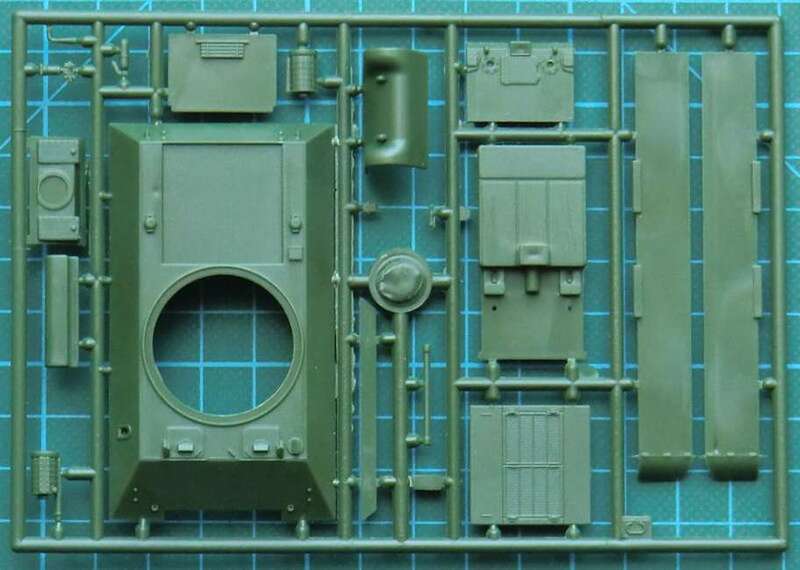 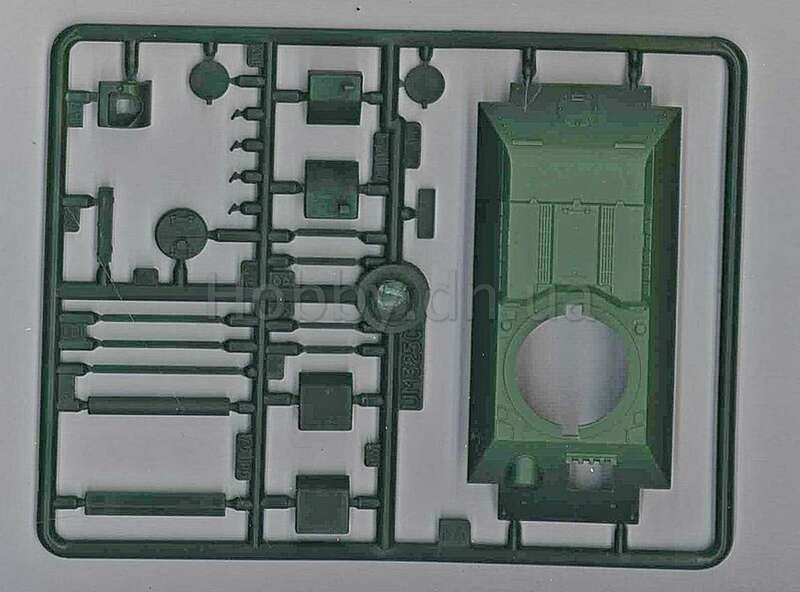 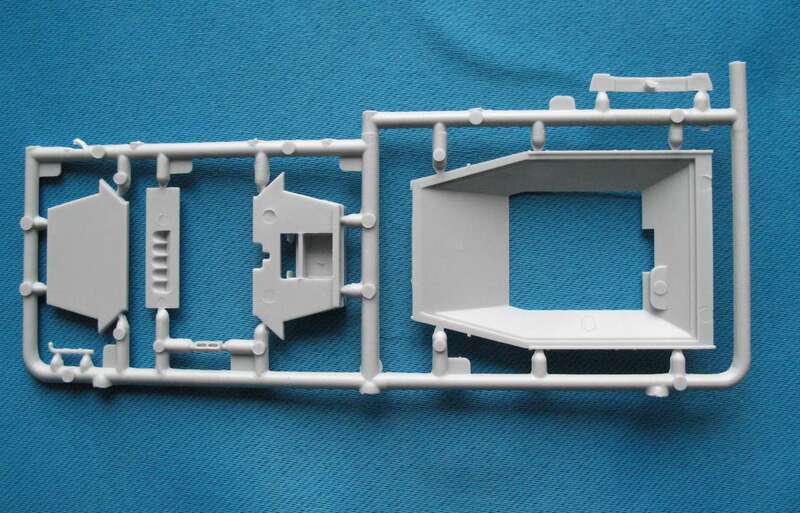 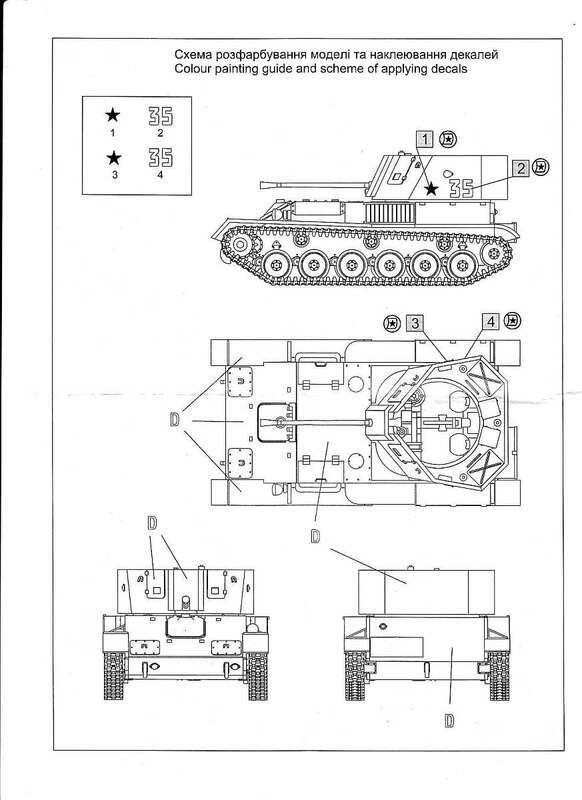 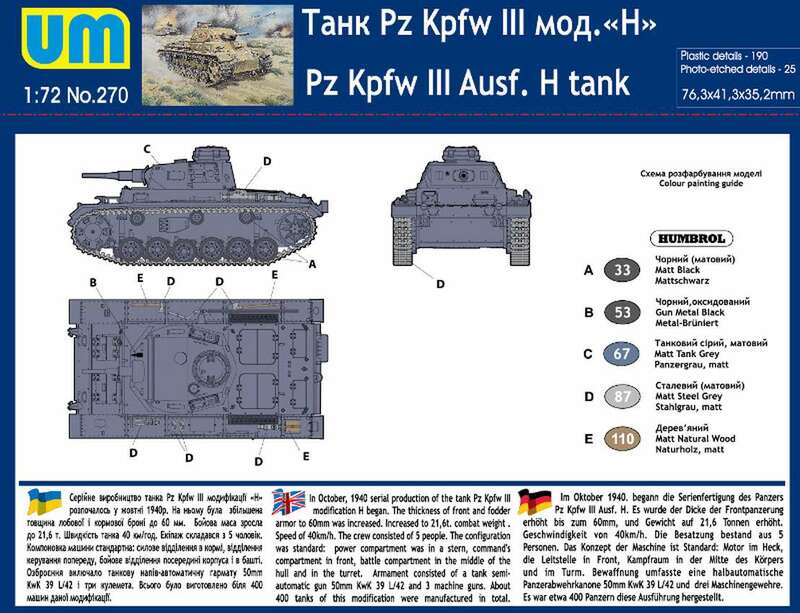 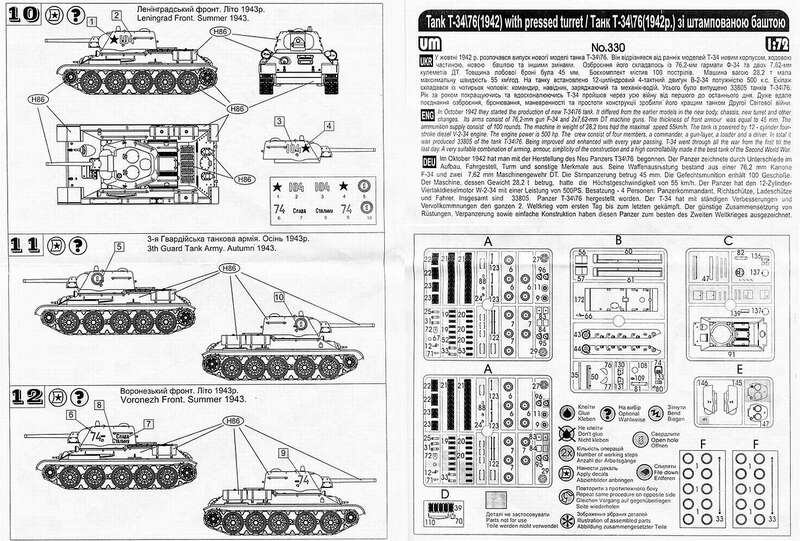 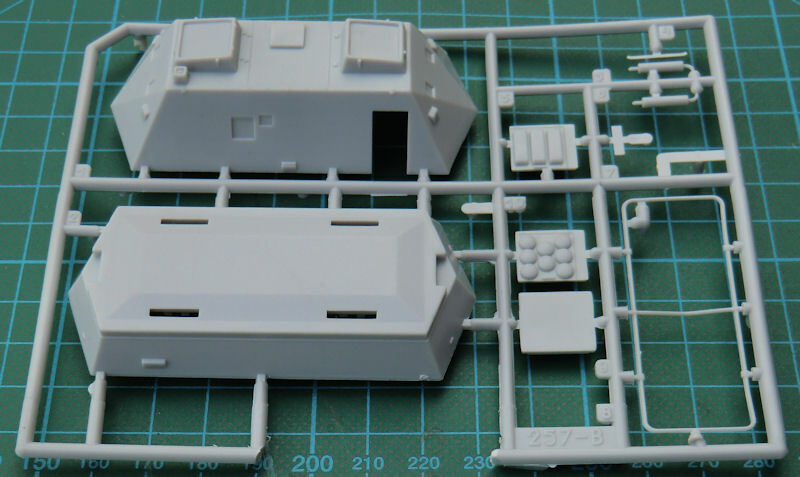 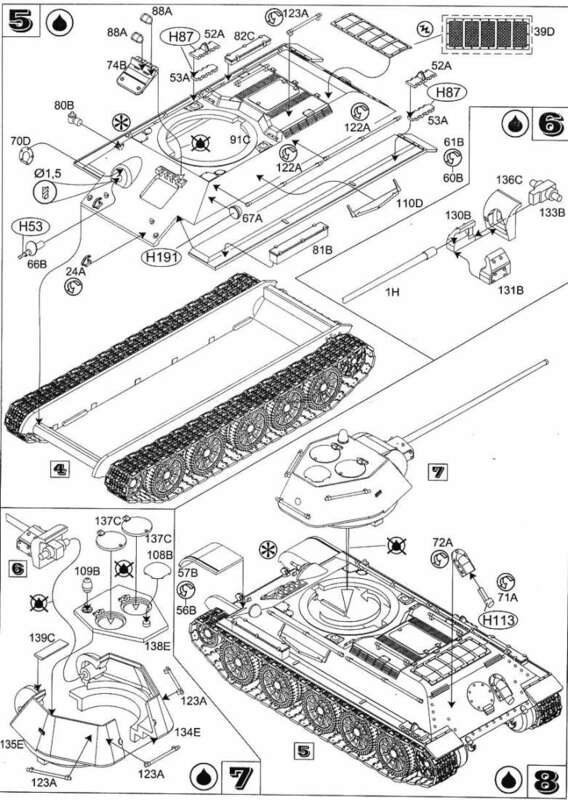 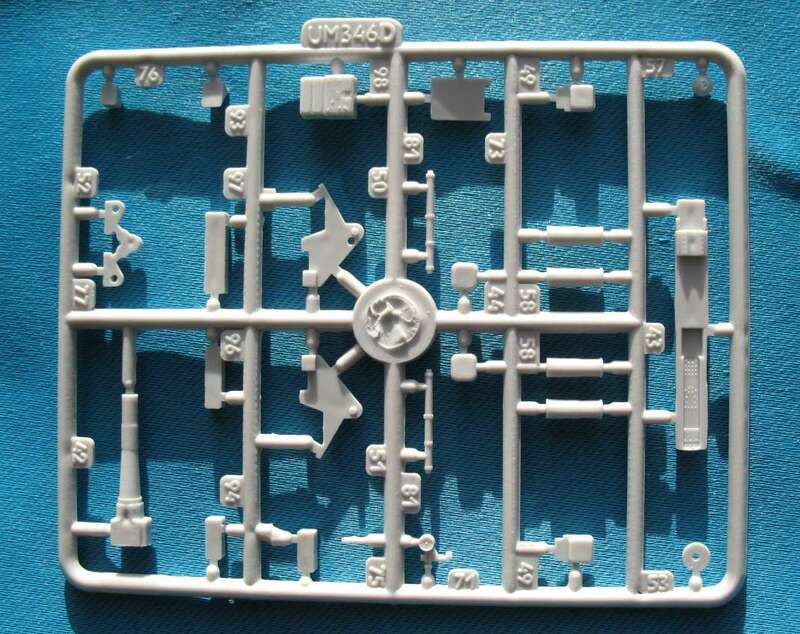 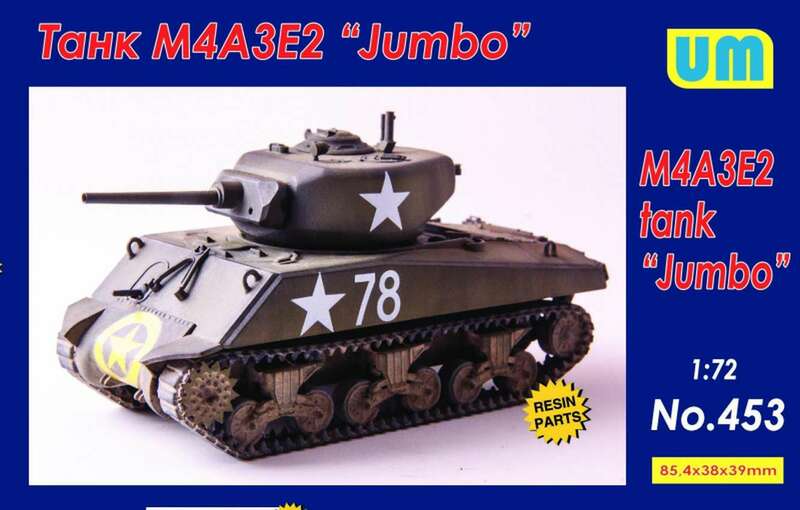 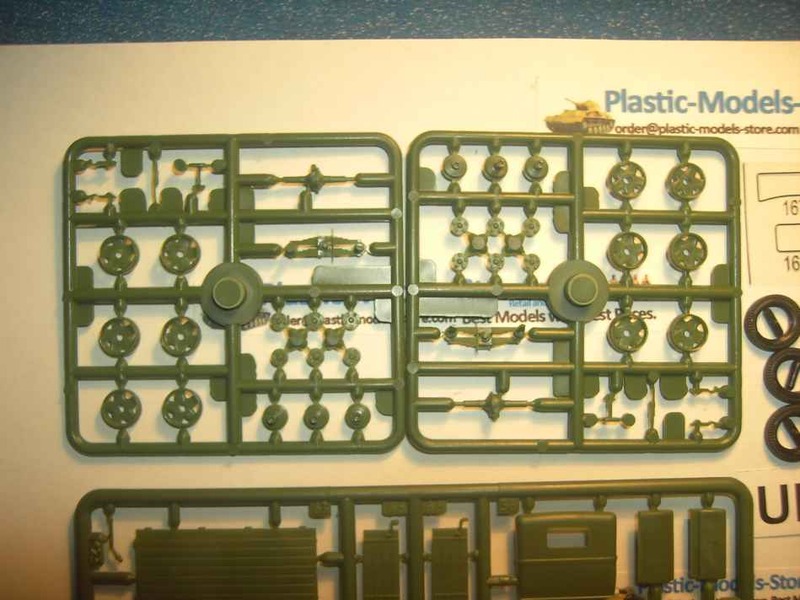 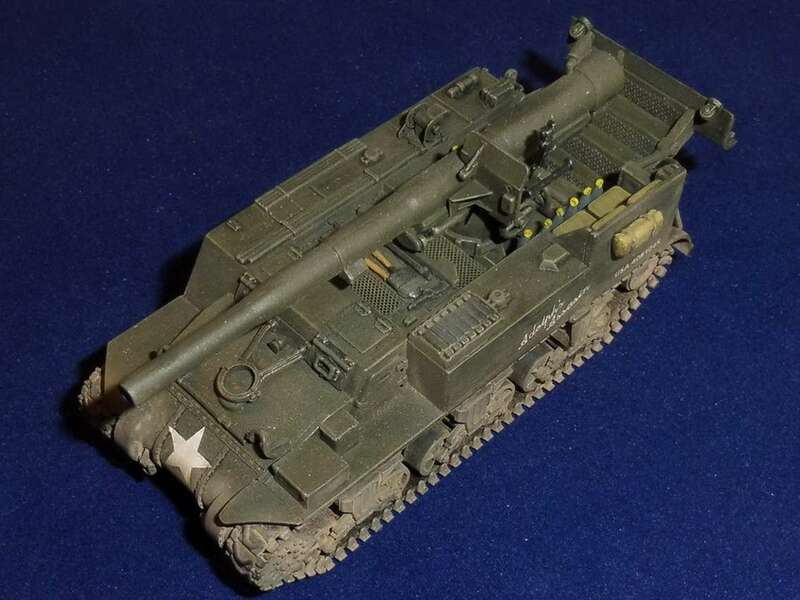 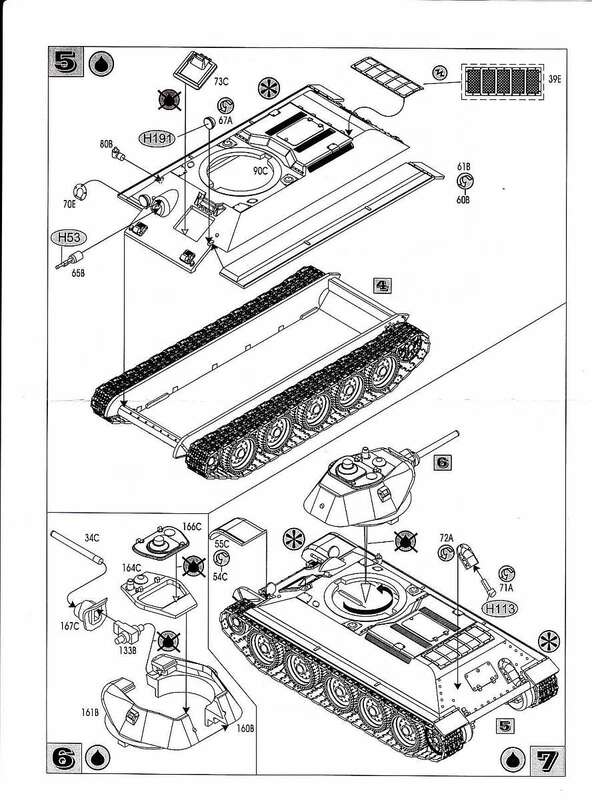 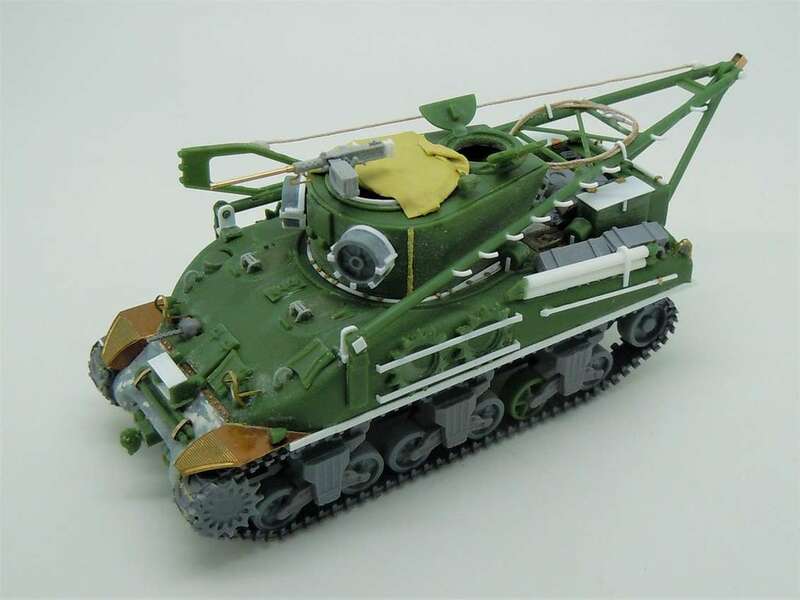 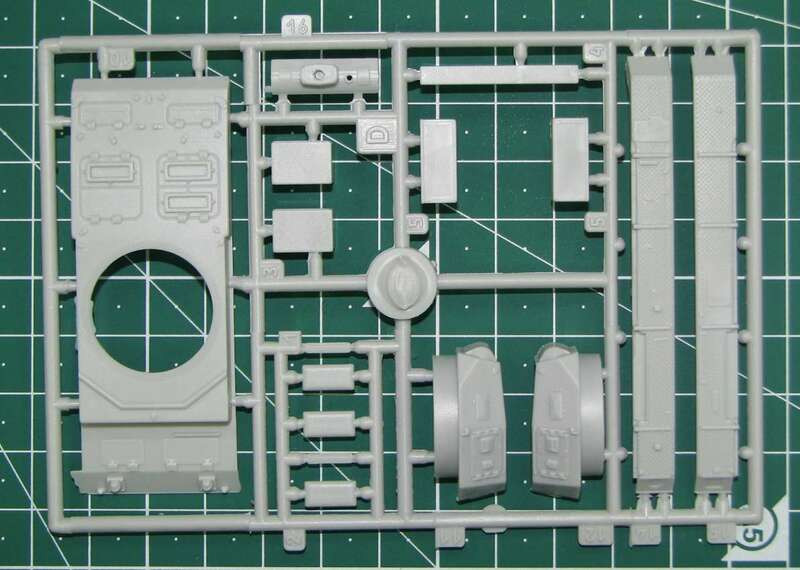 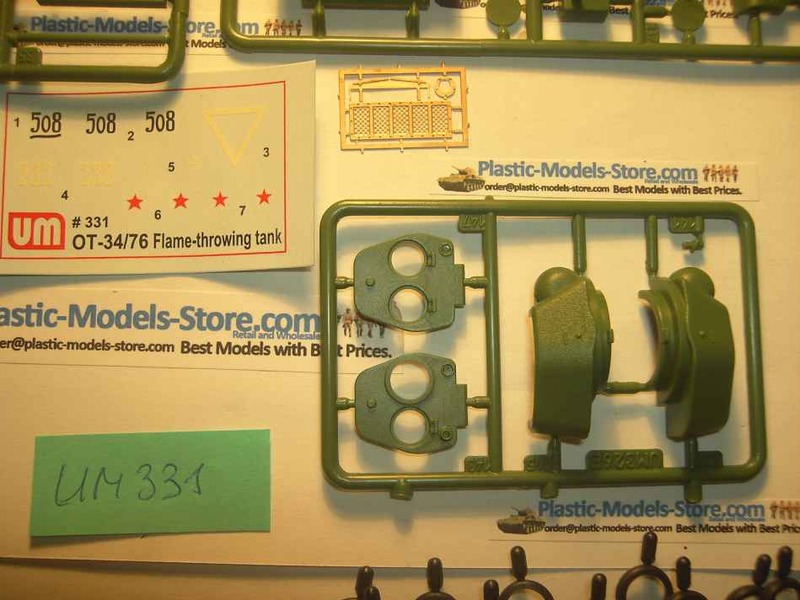 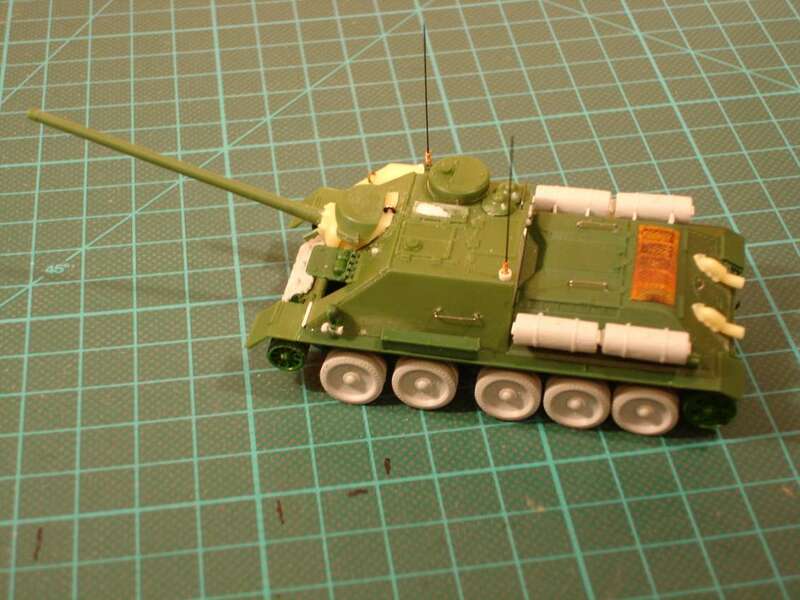 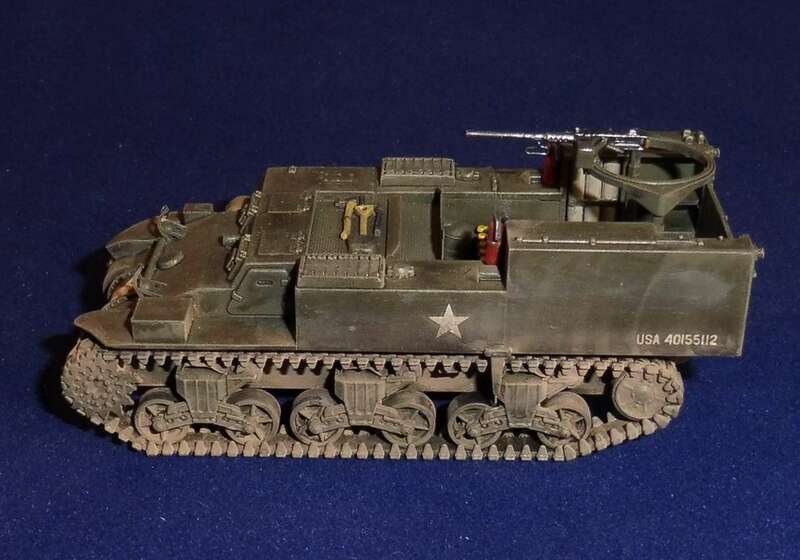 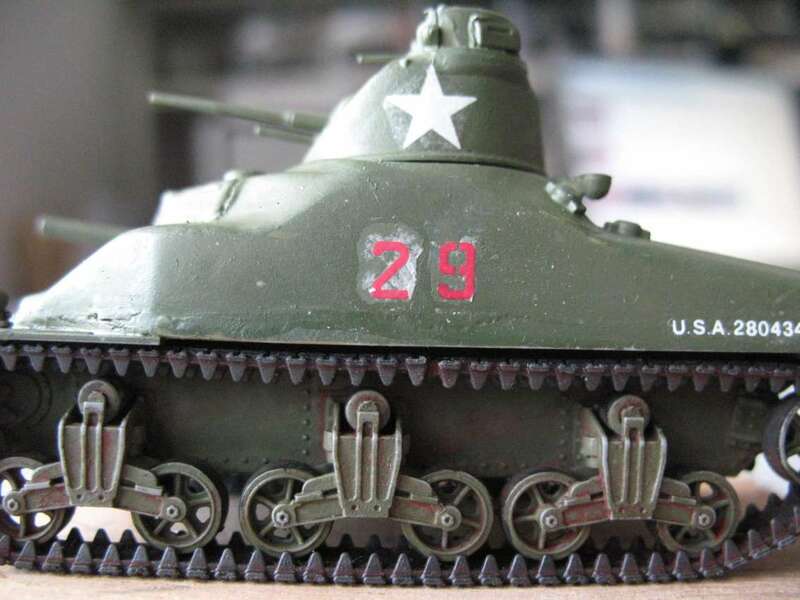 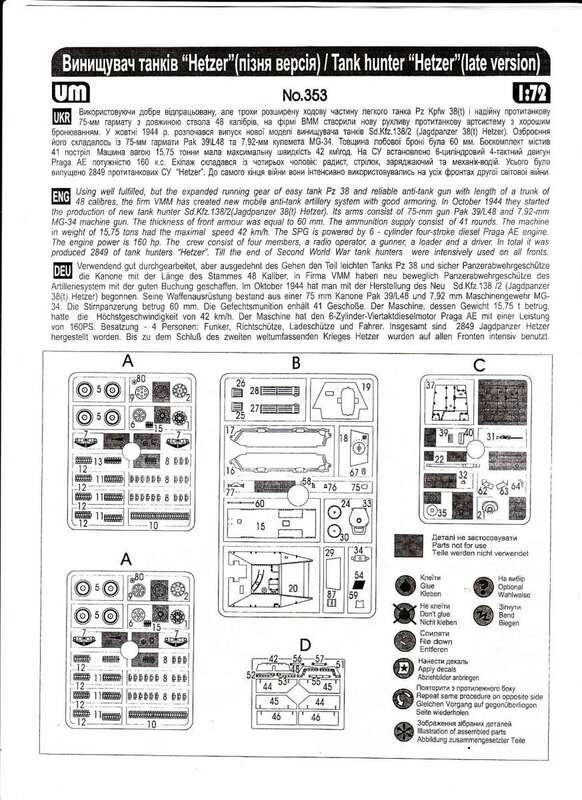 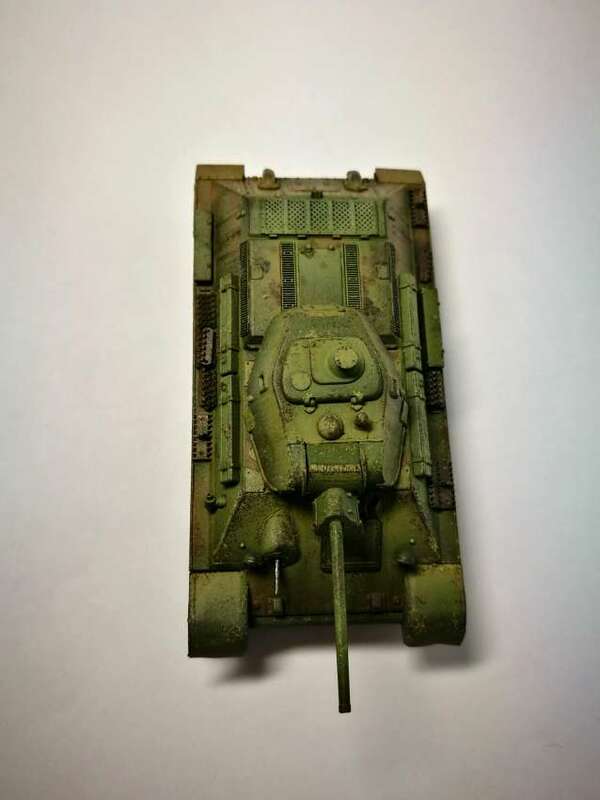 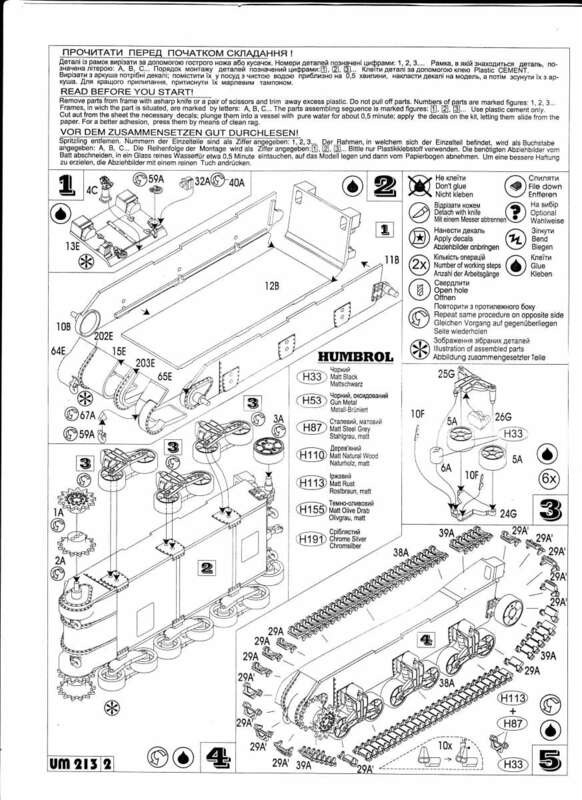 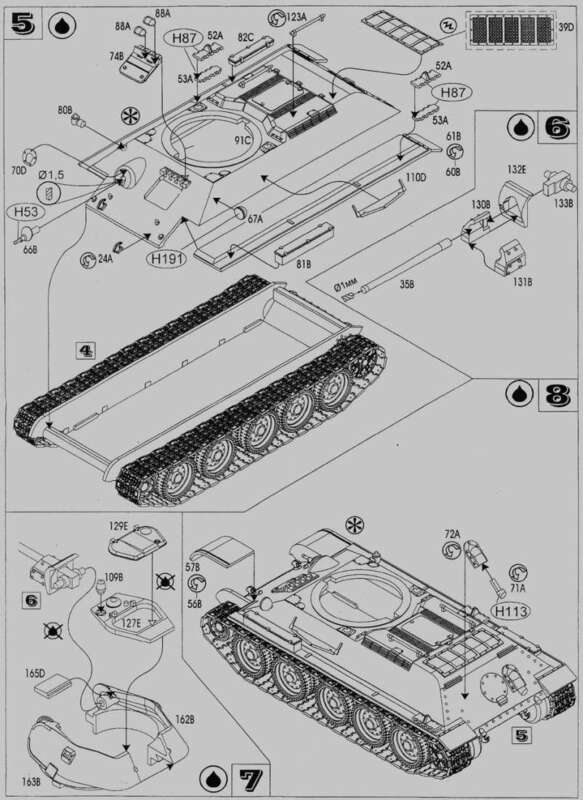 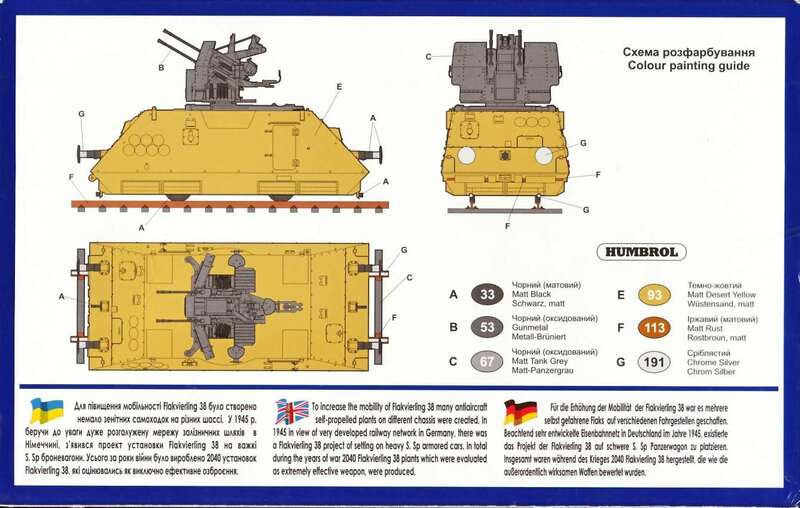 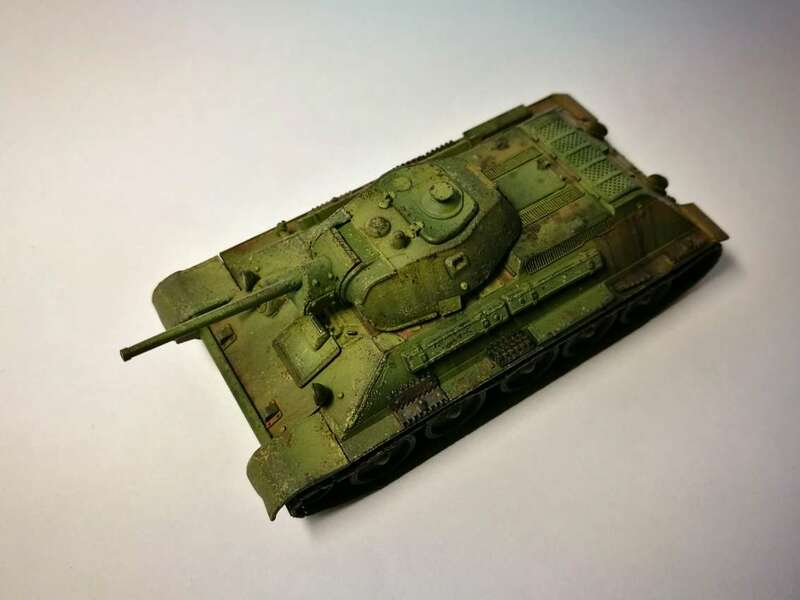 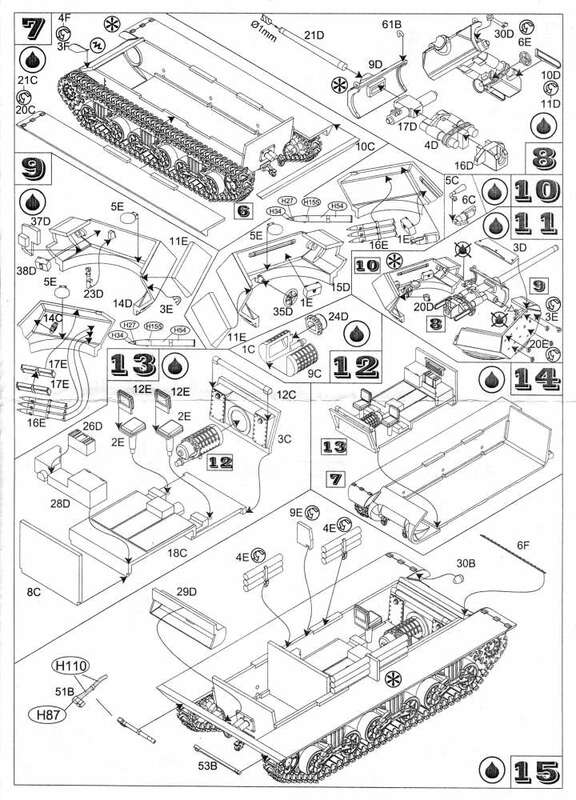 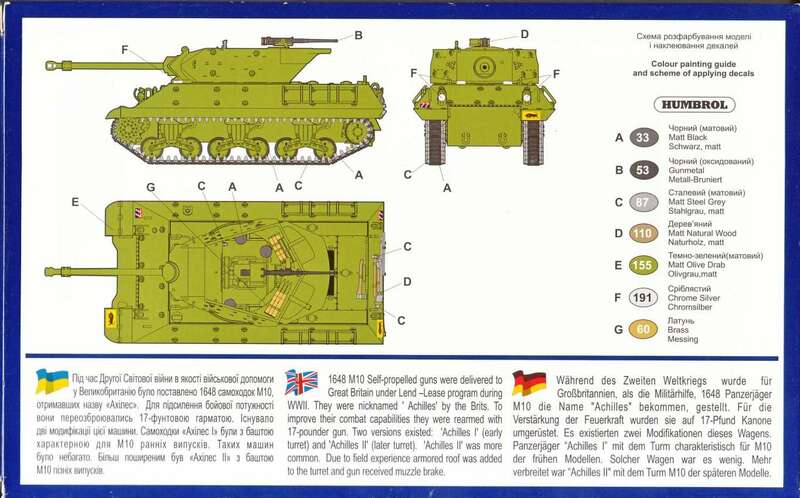 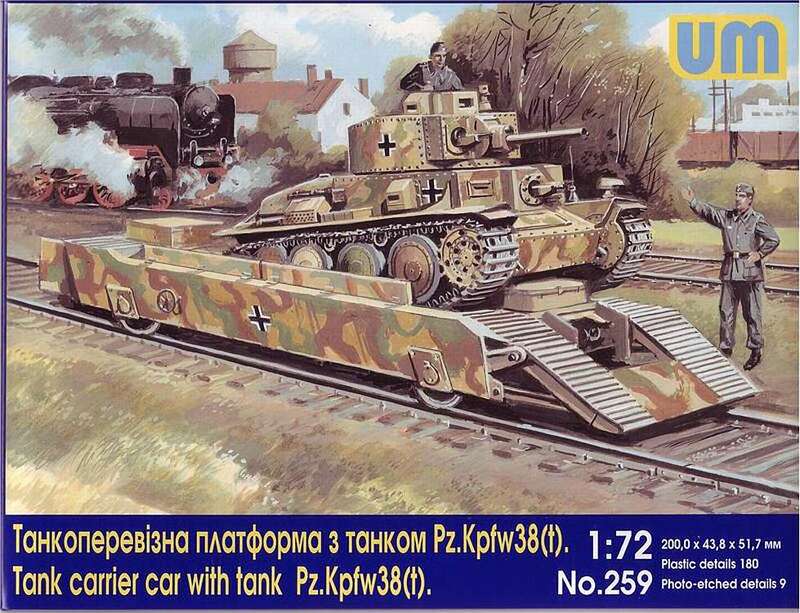 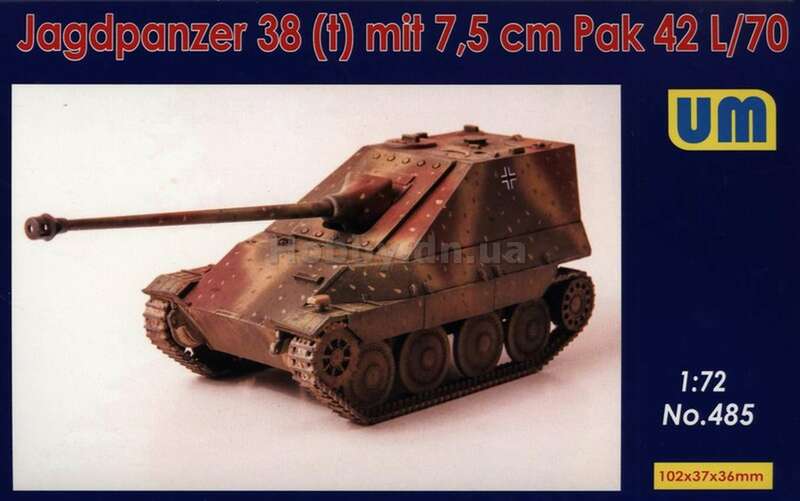 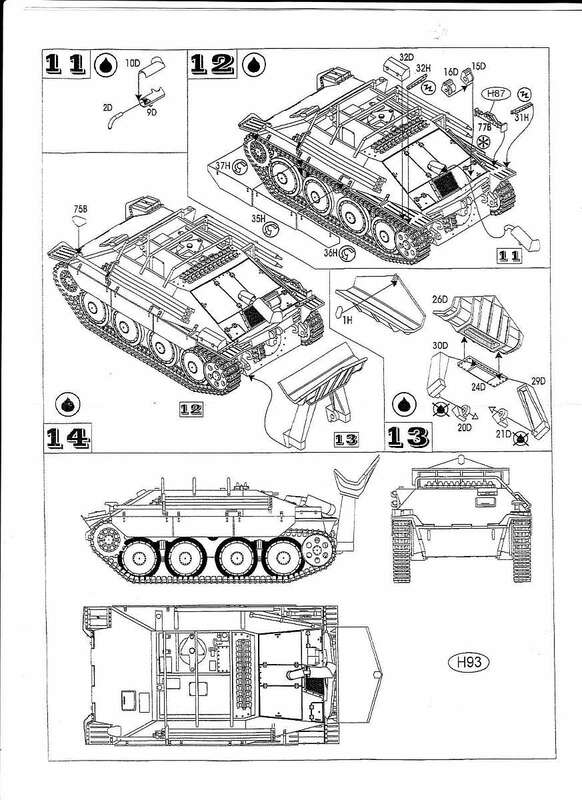 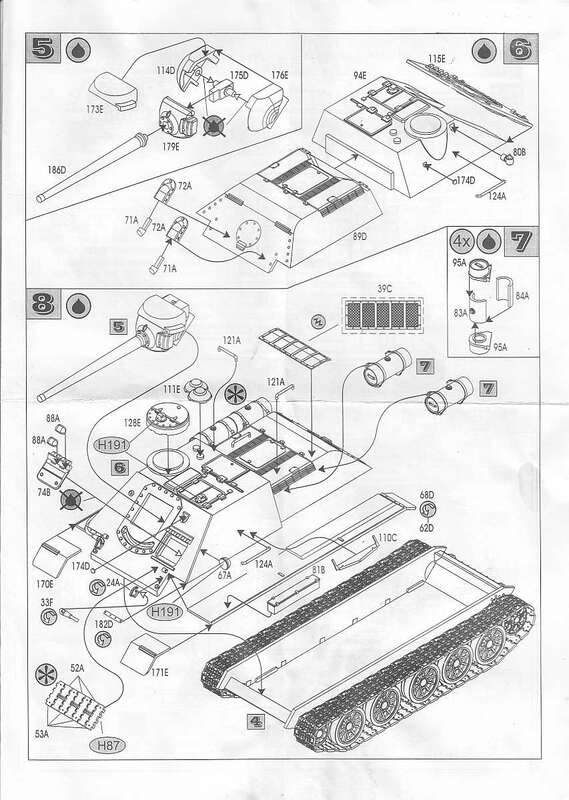 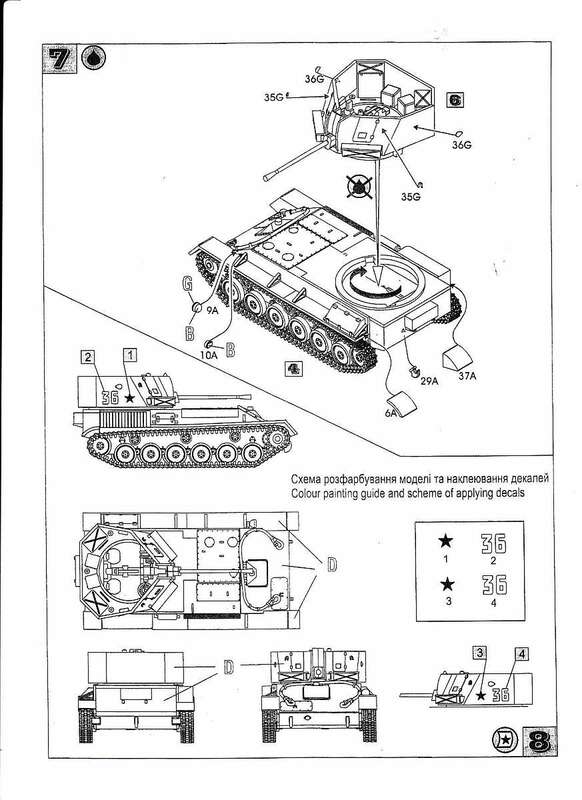 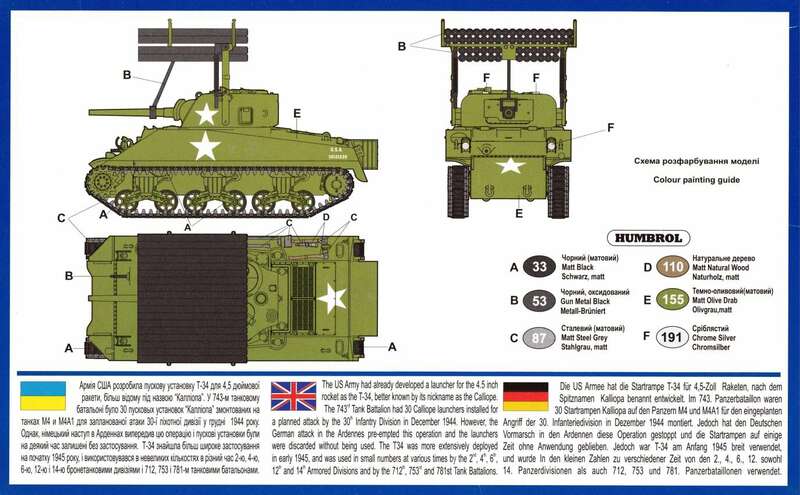 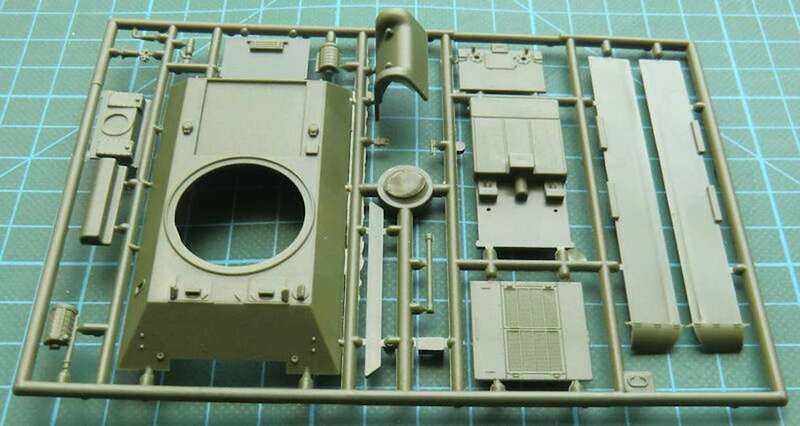 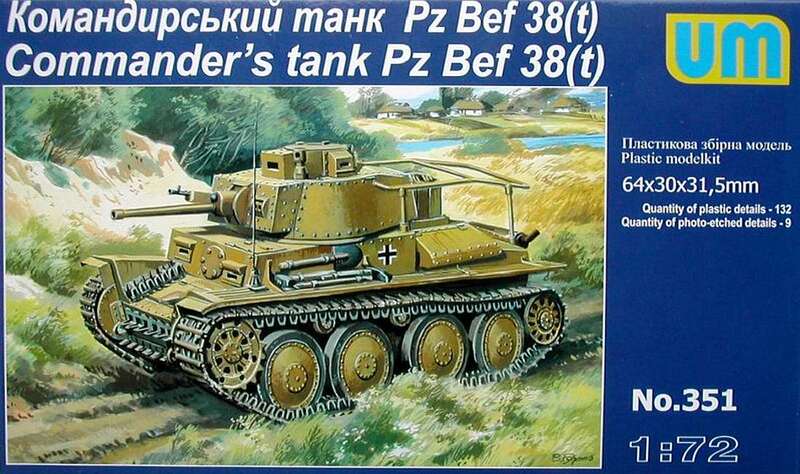 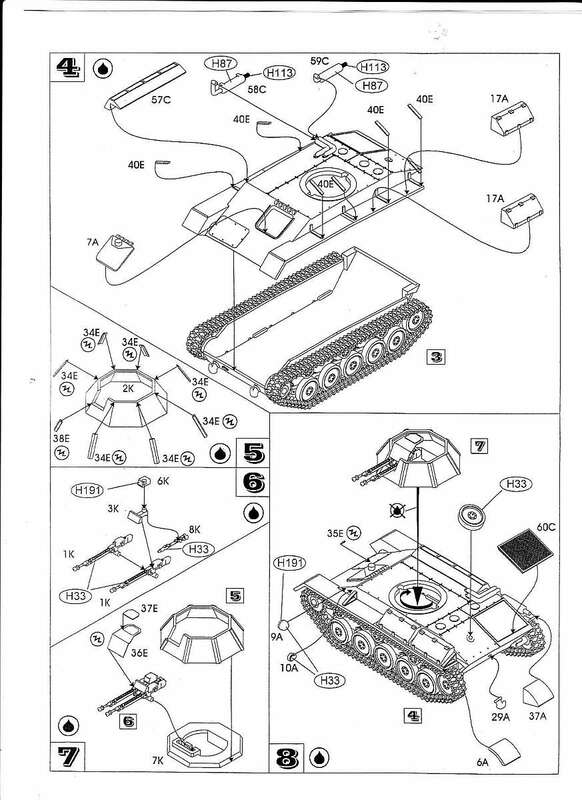 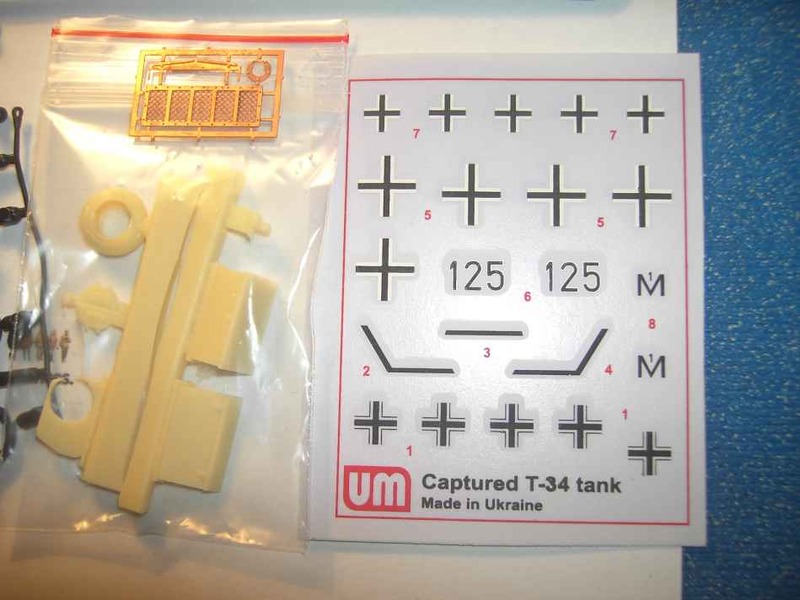 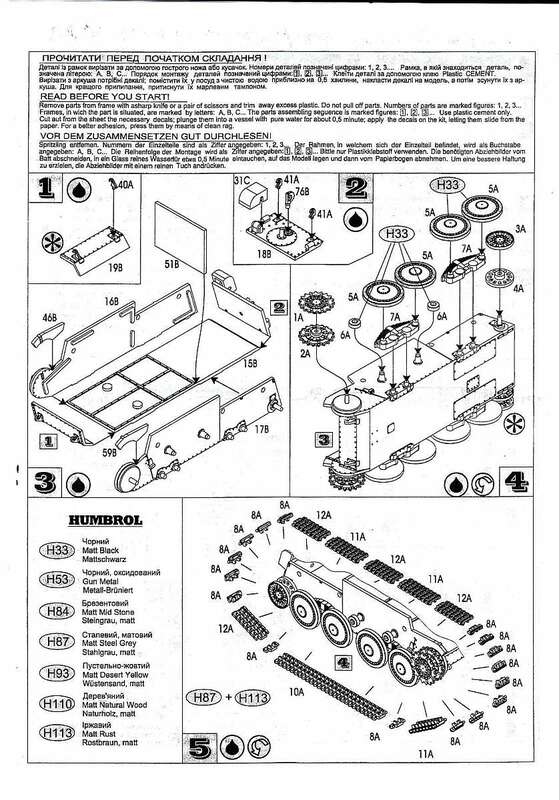 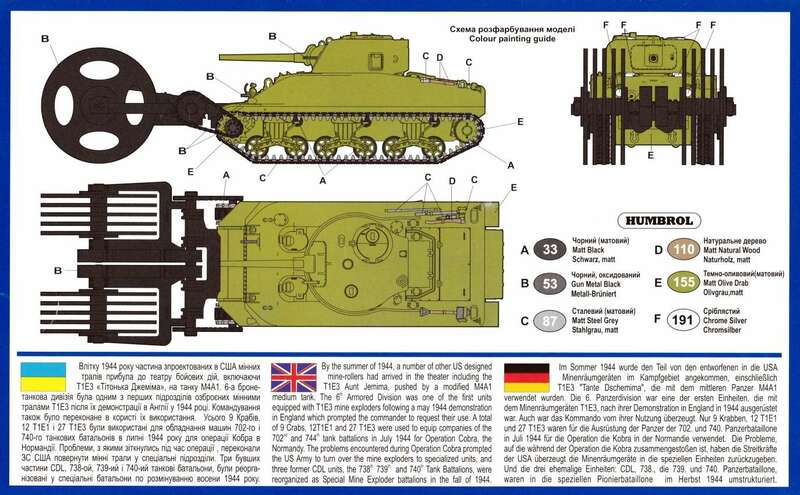 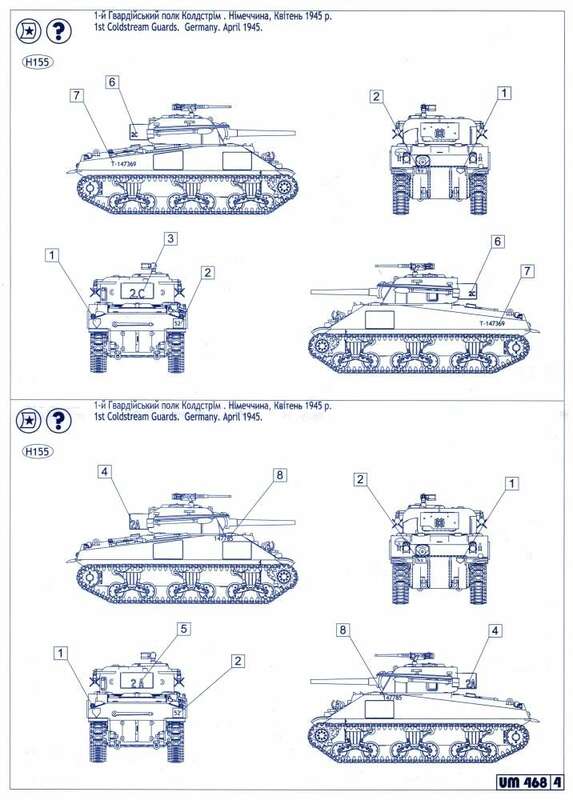 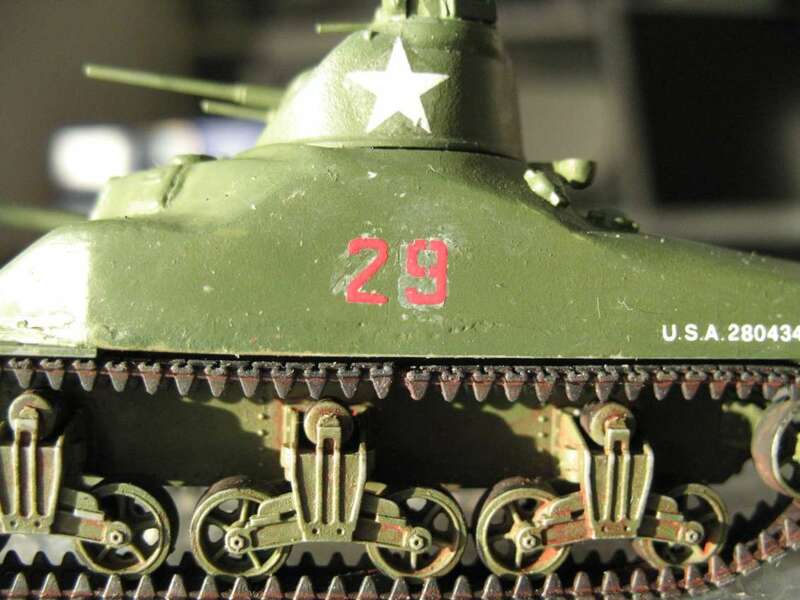 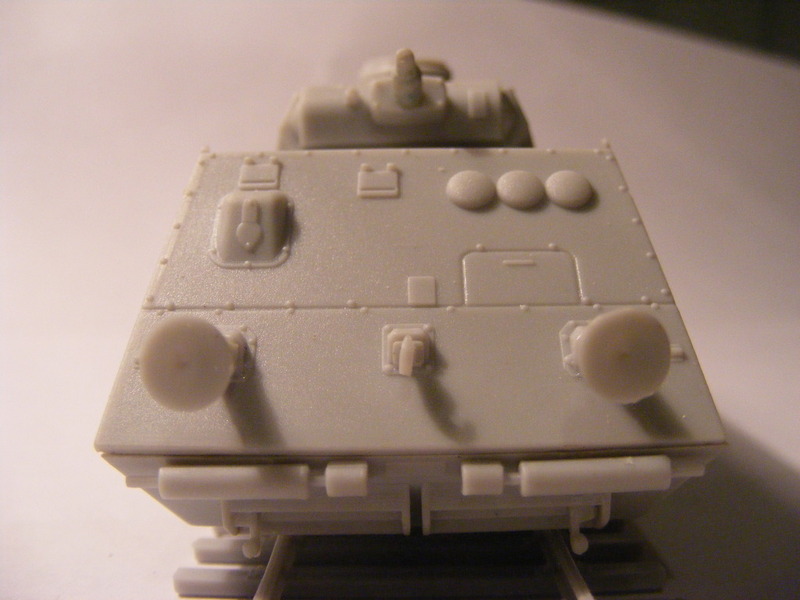 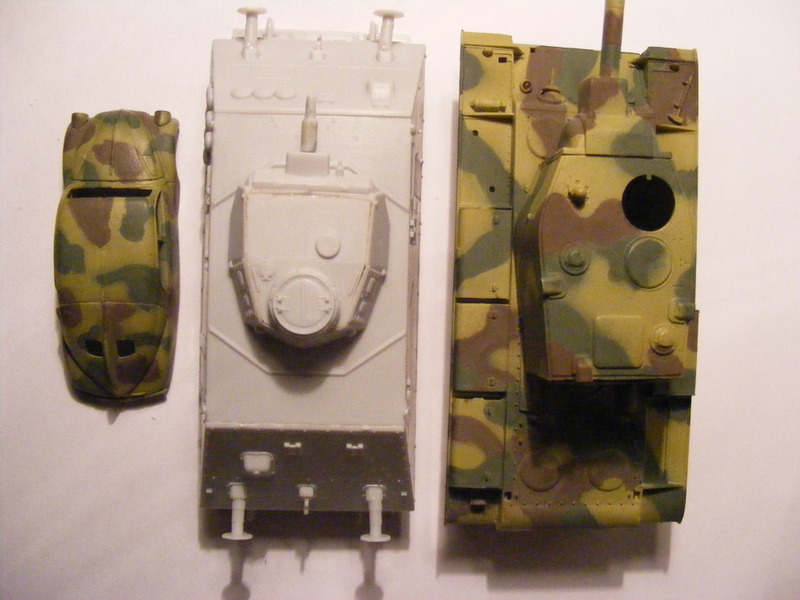 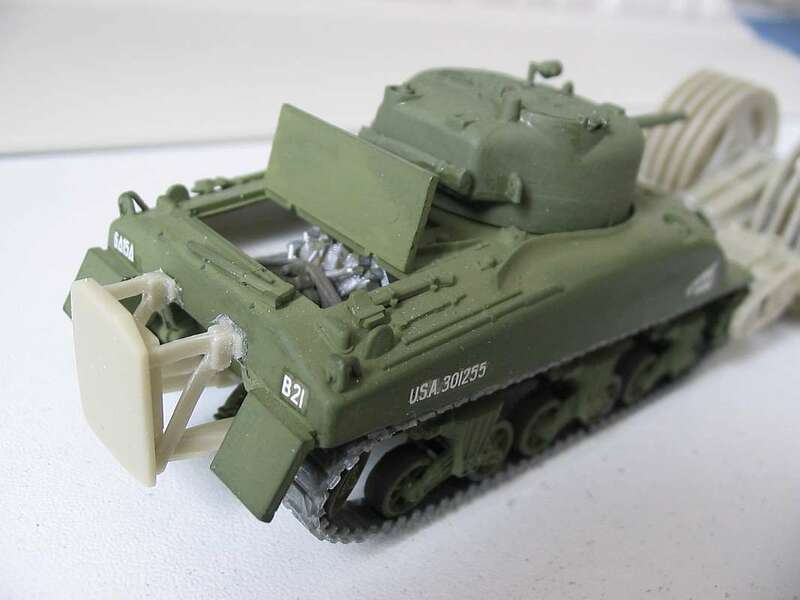 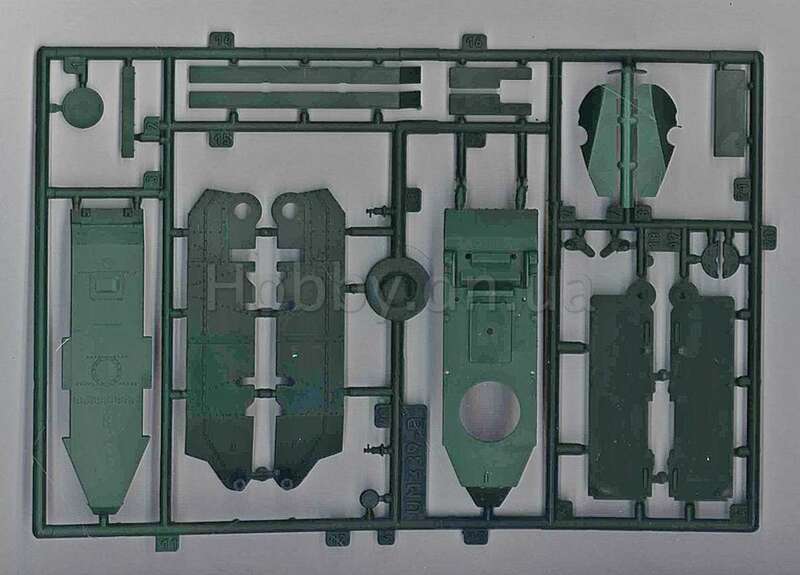 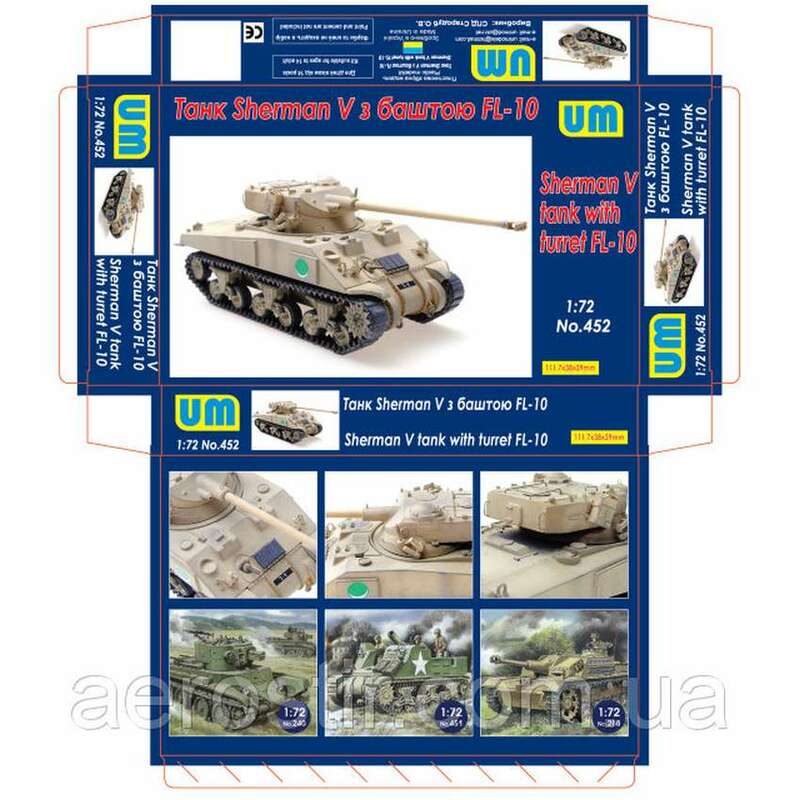 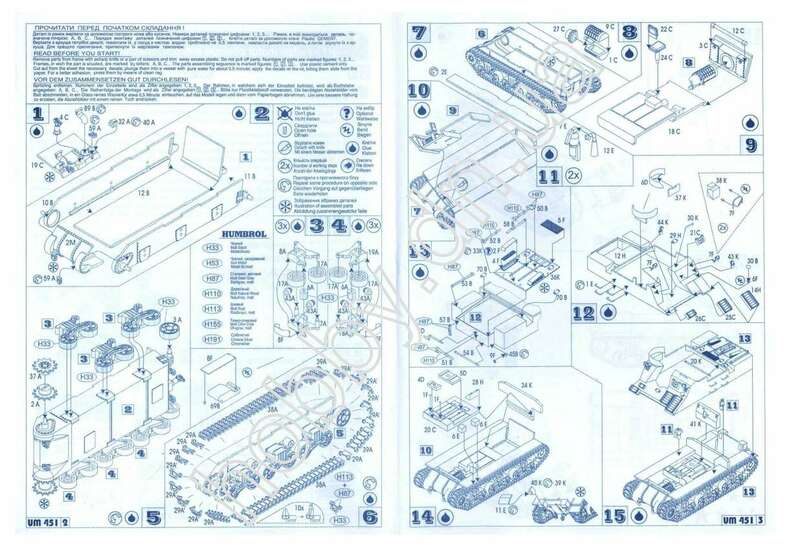 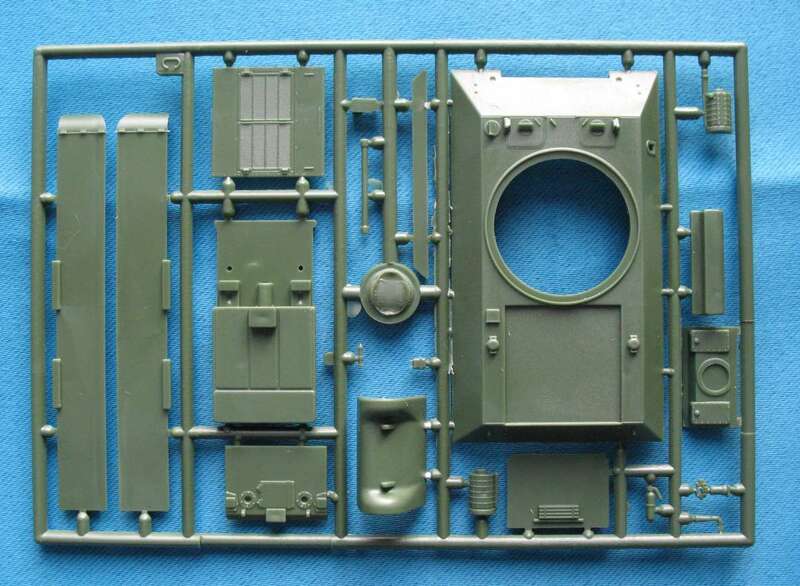 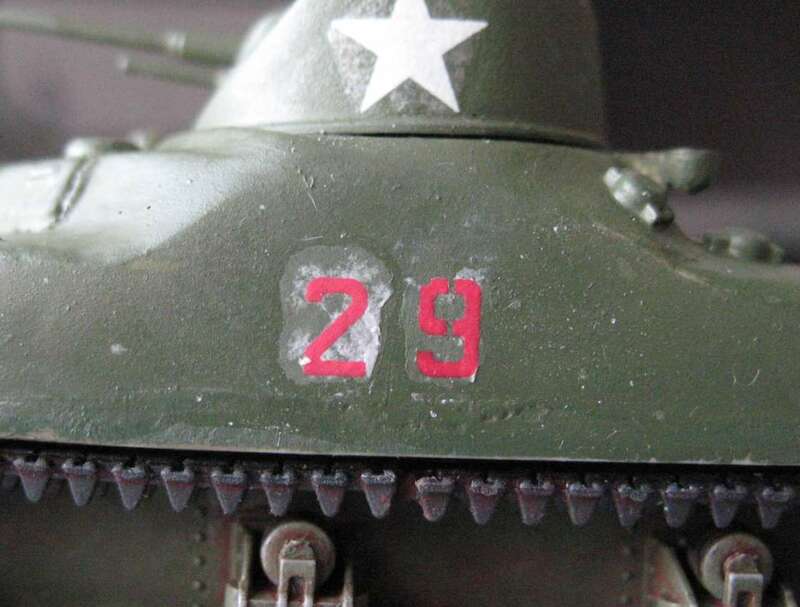 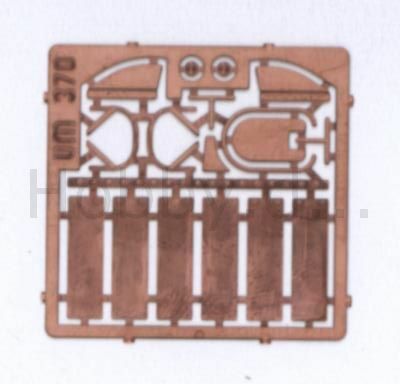 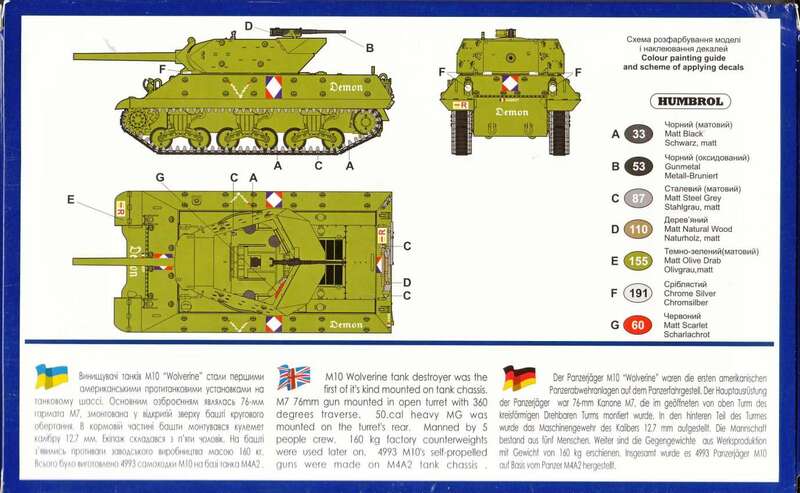 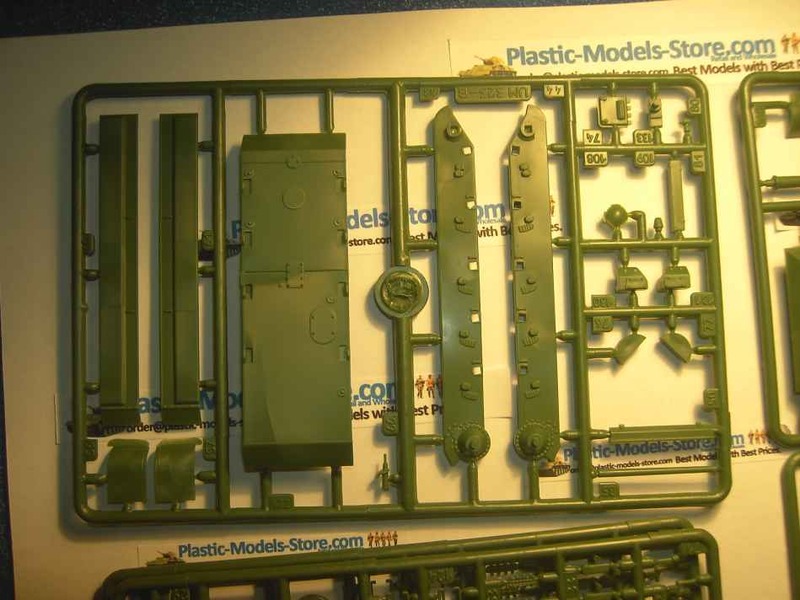 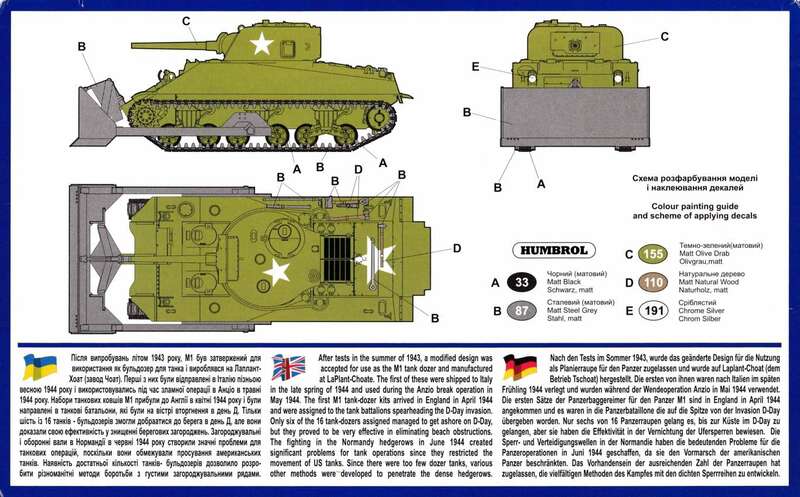 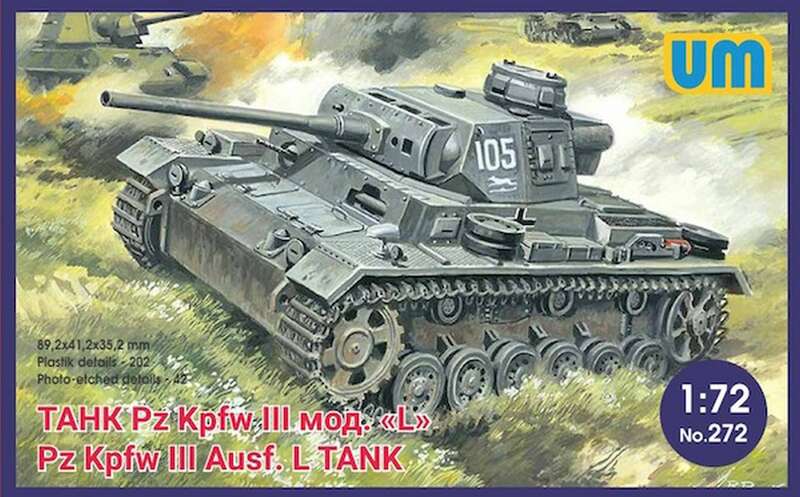 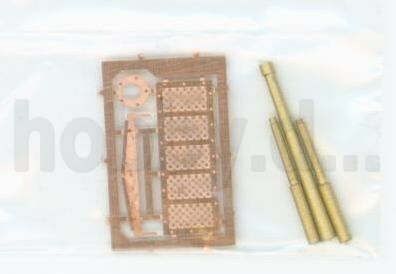 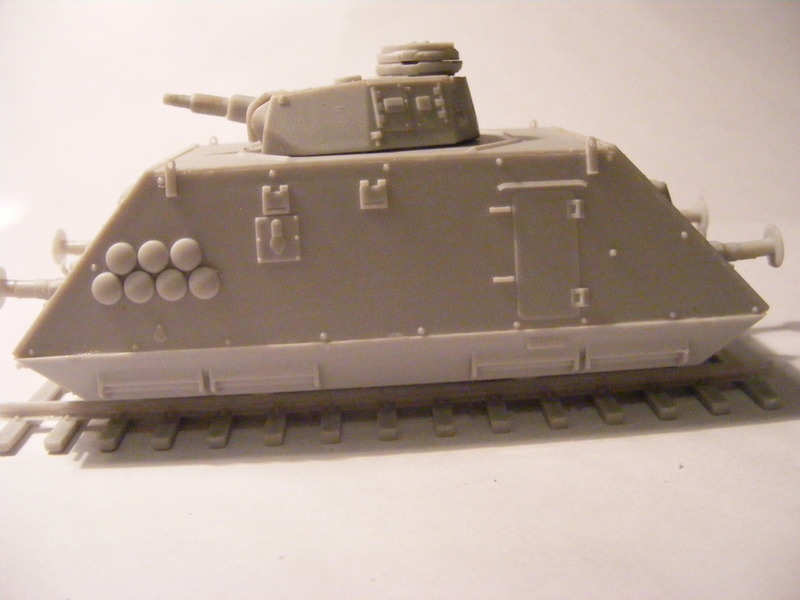 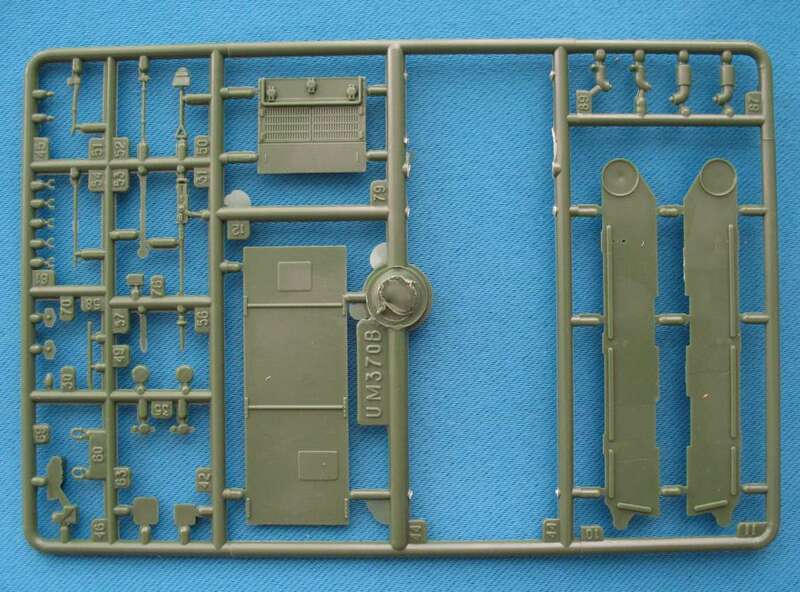 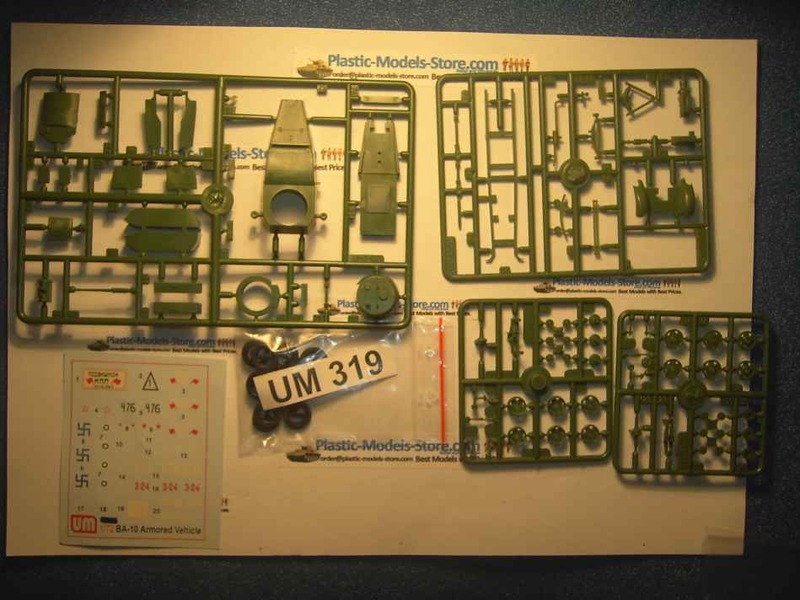 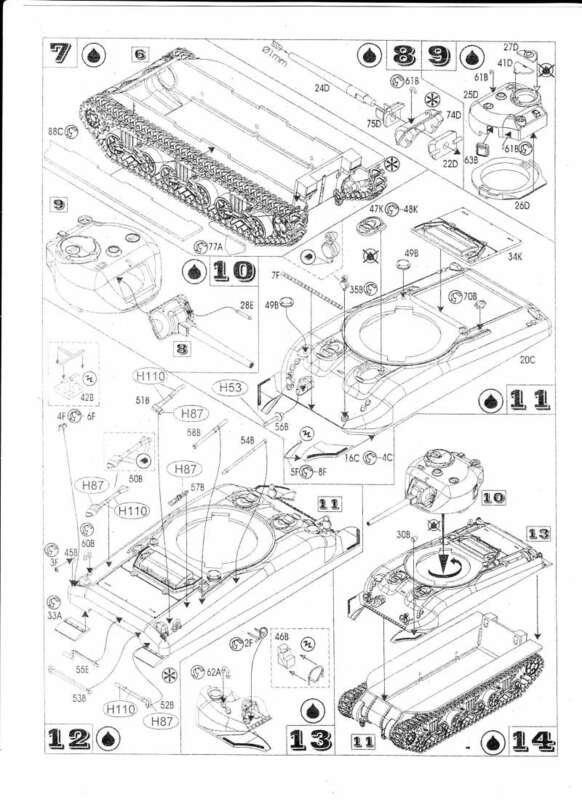 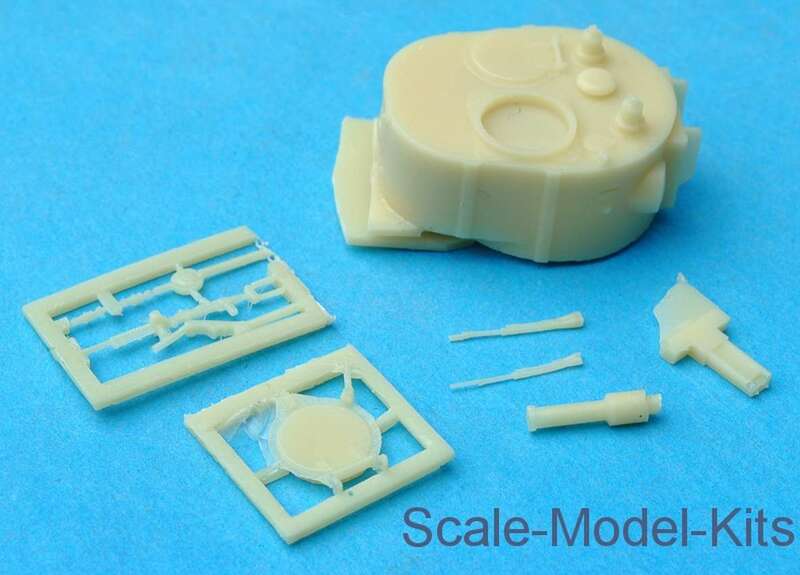 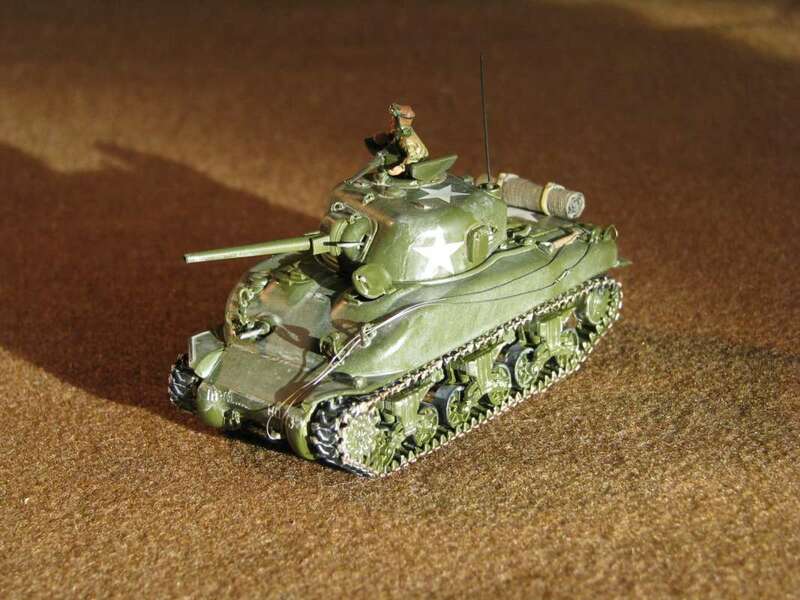 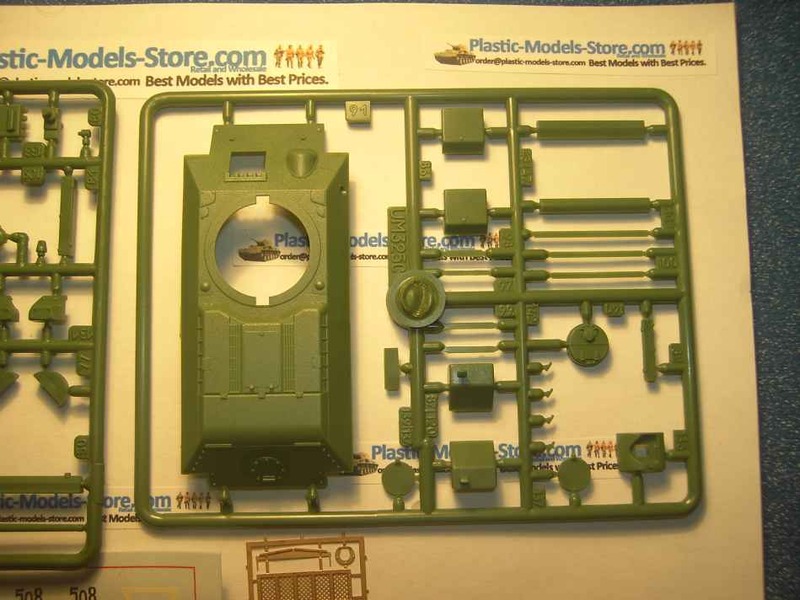 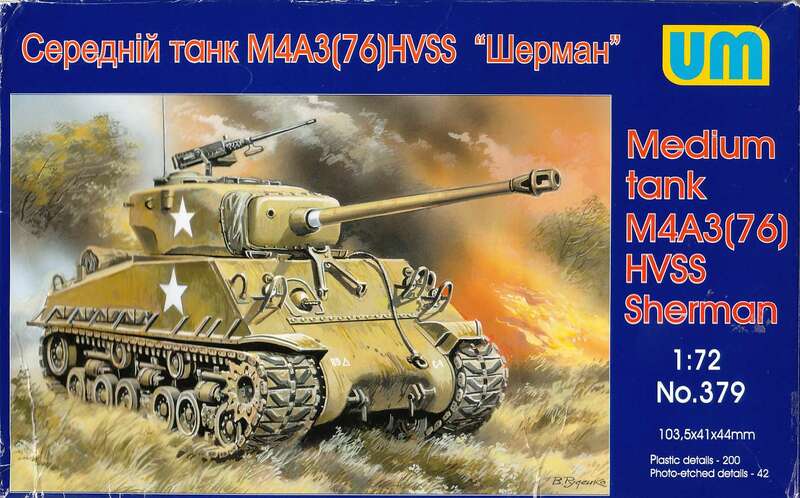 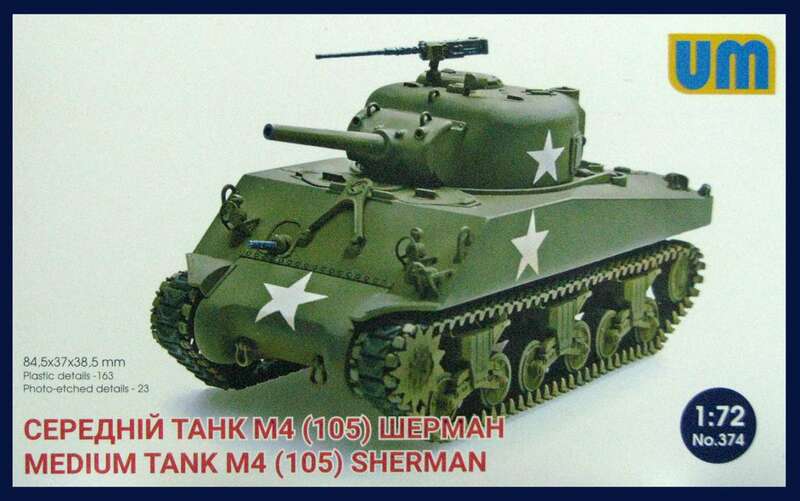 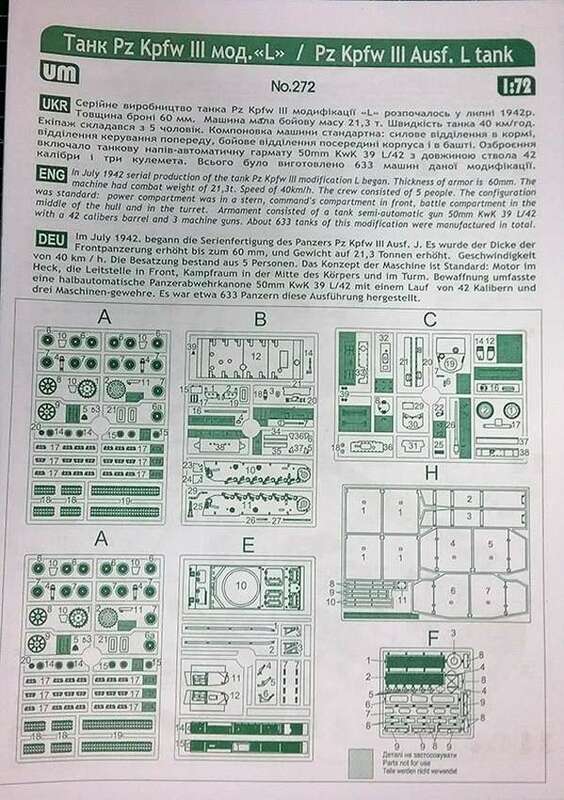 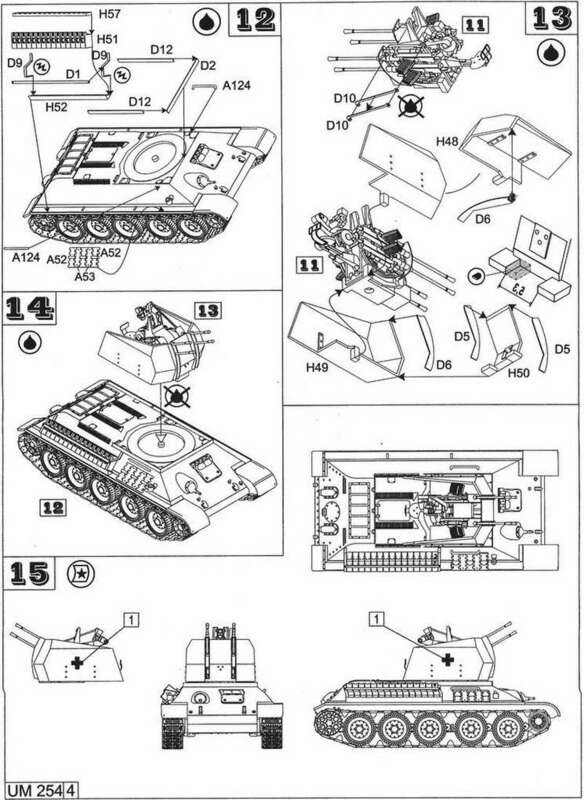 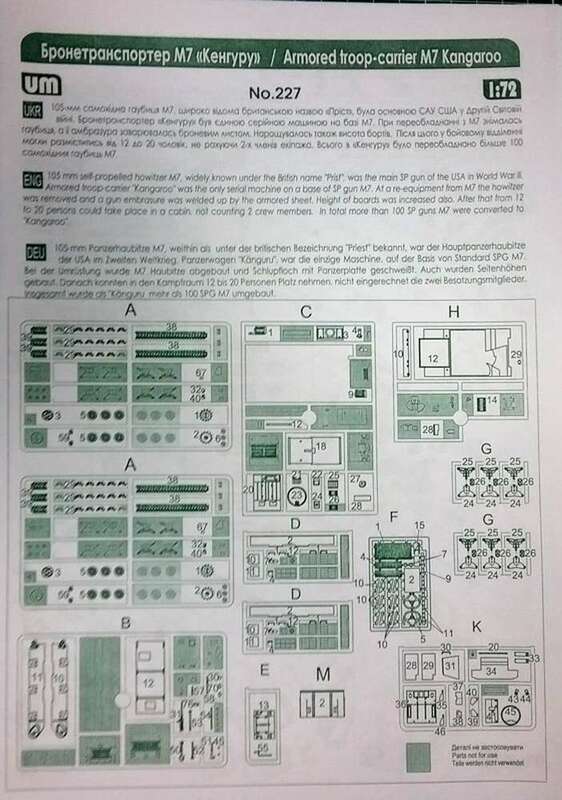 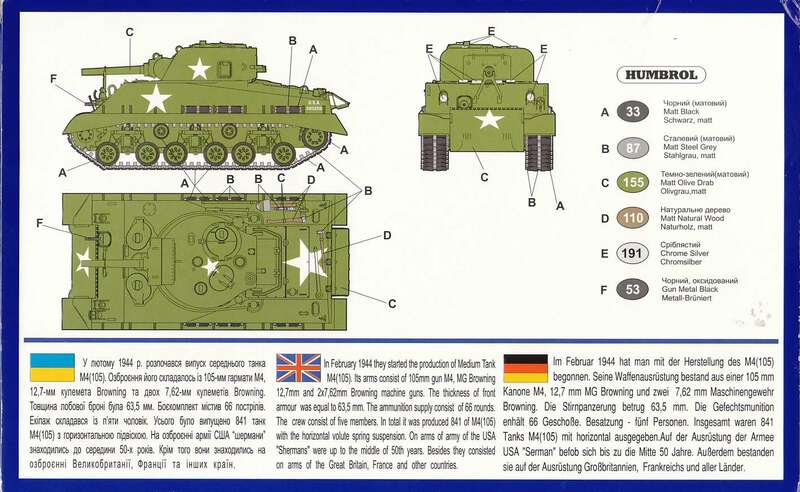 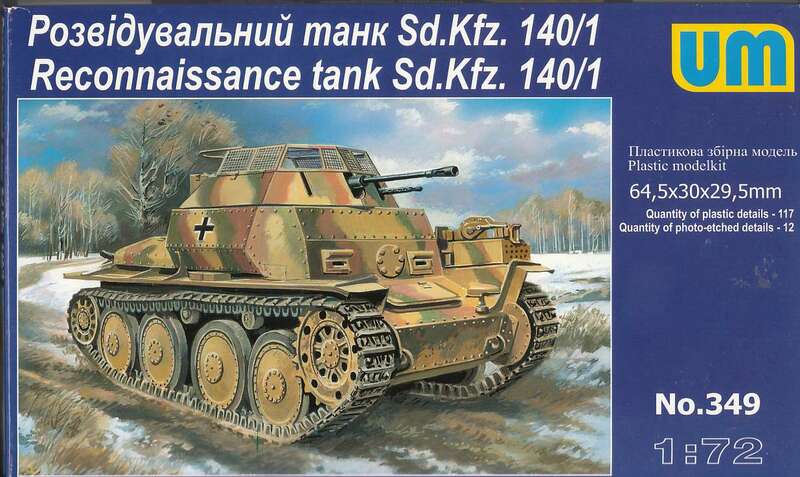 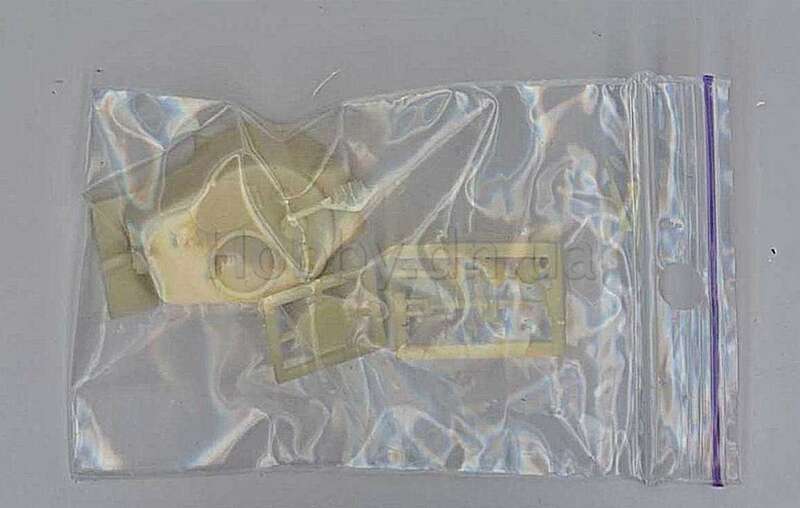 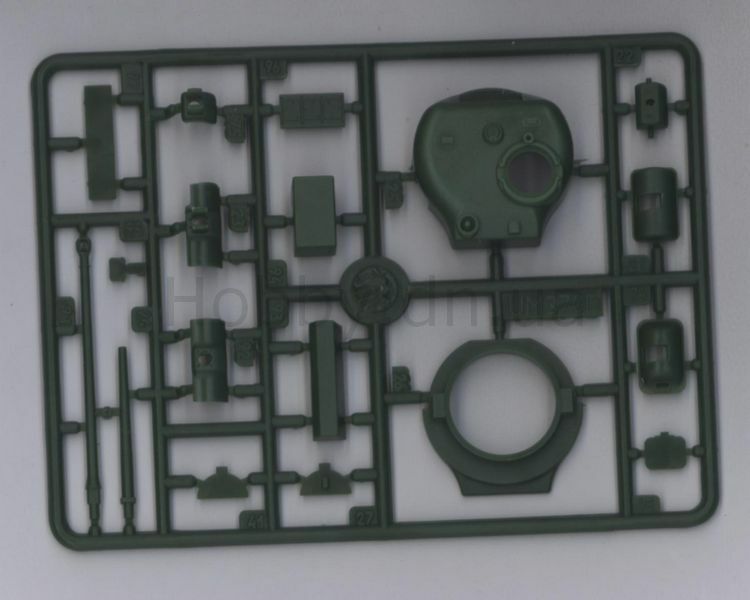 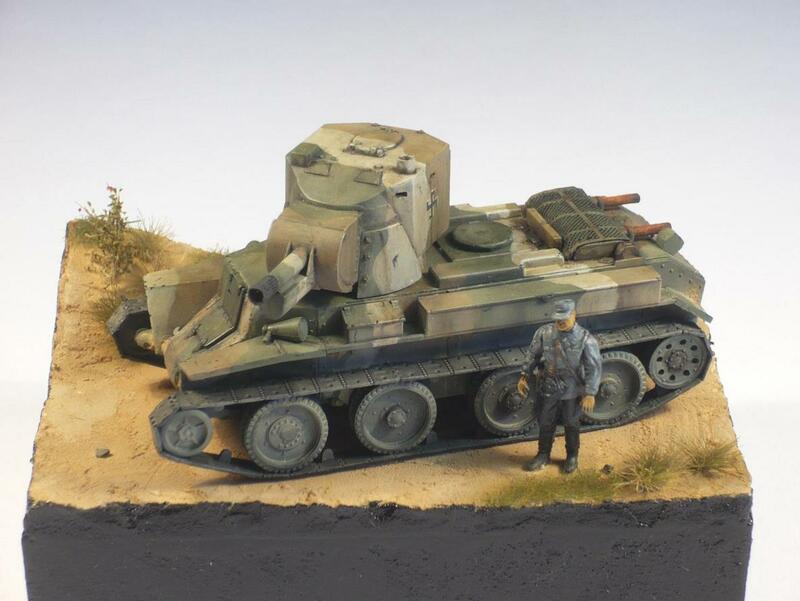 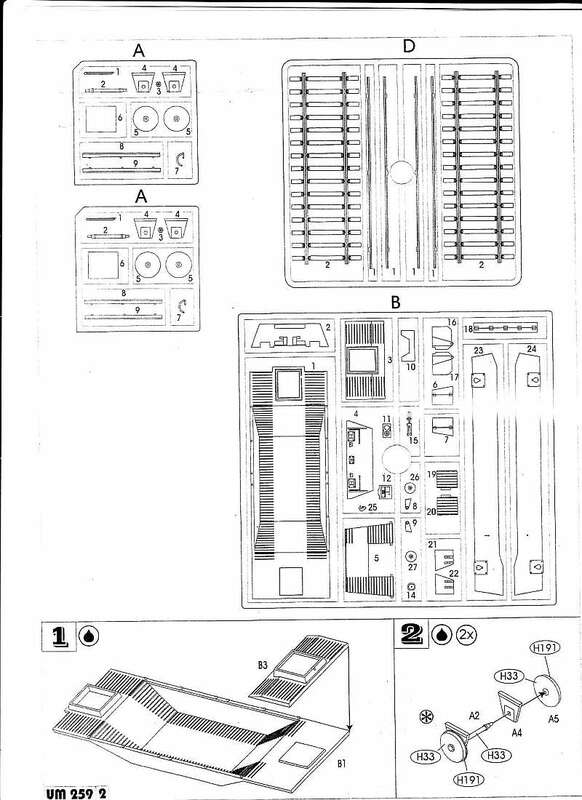 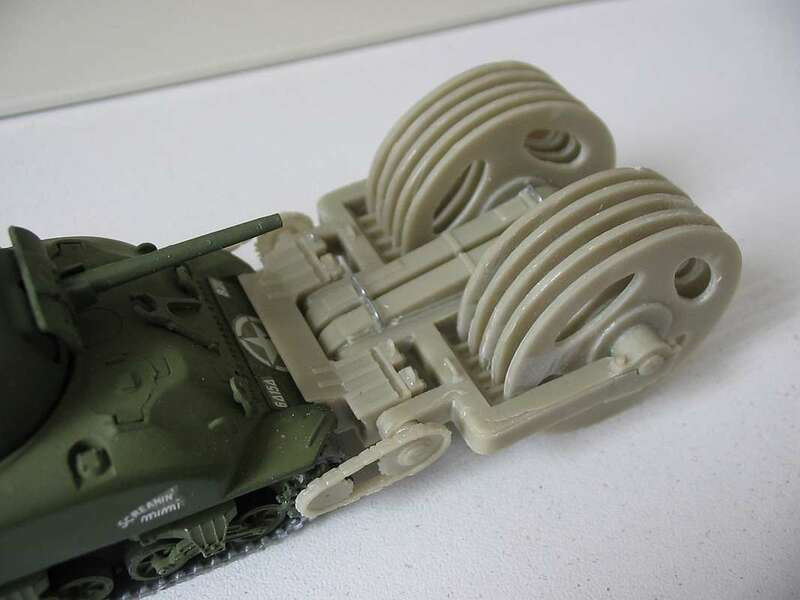 There's also a small fret of photo etched parts and a decal sheet with markings for three tanks (one is shown in a colour three view on the back of the box). 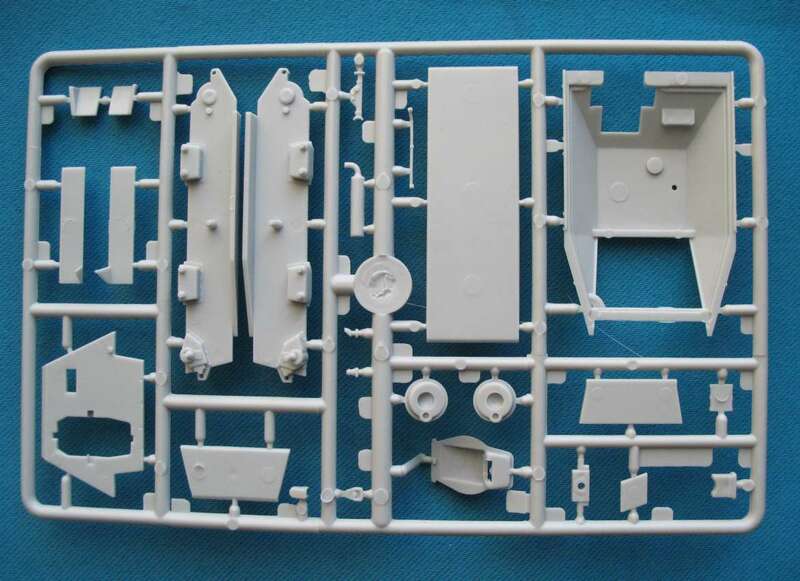 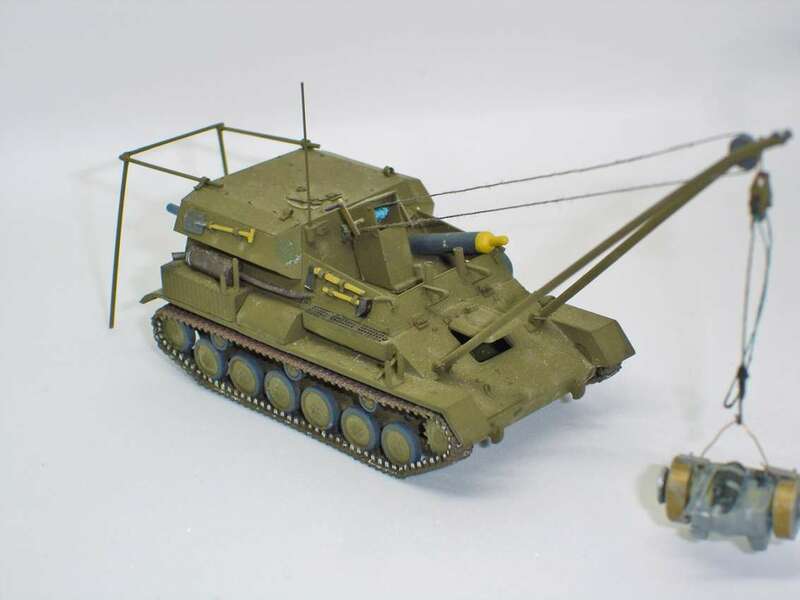 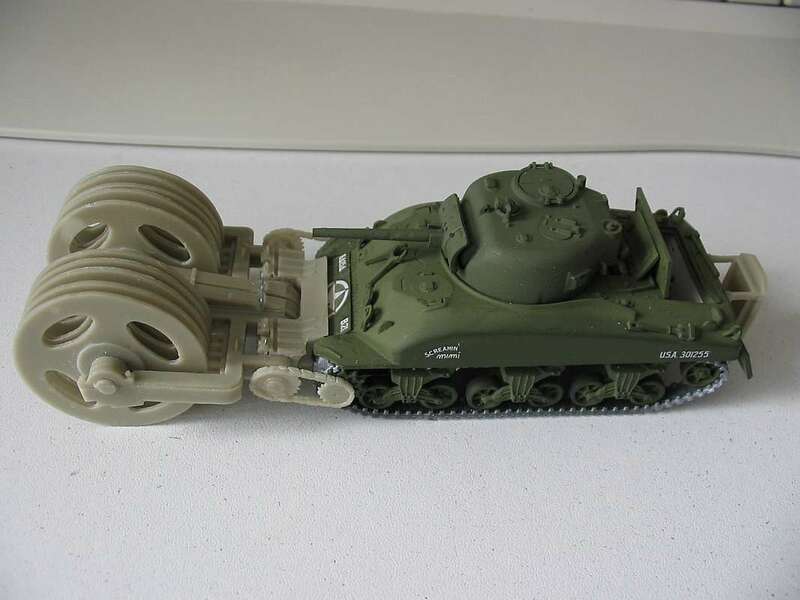 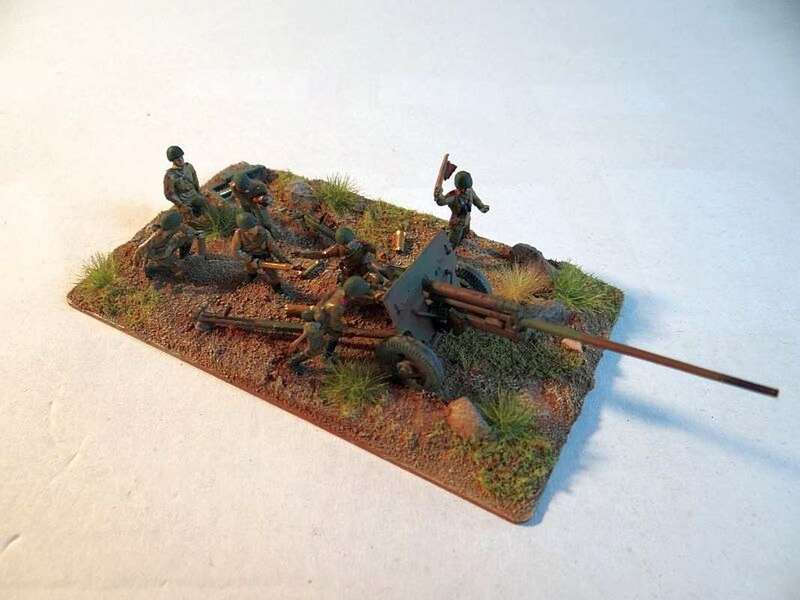 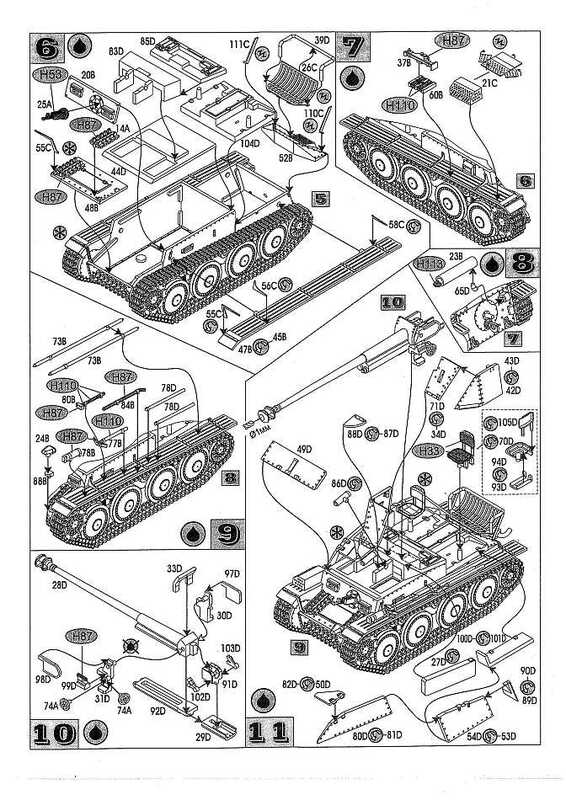 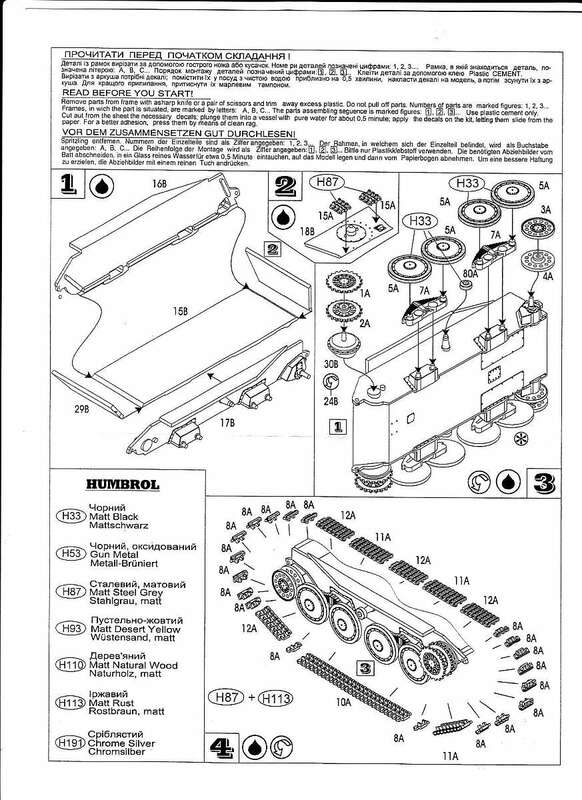 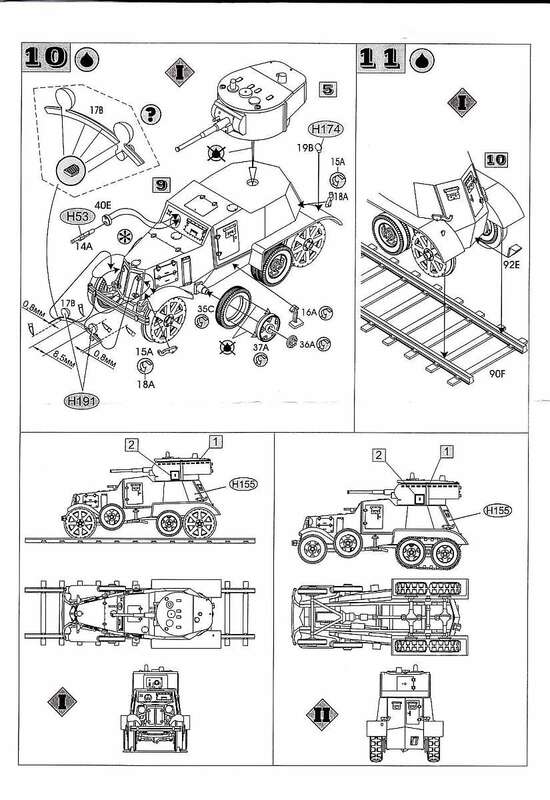 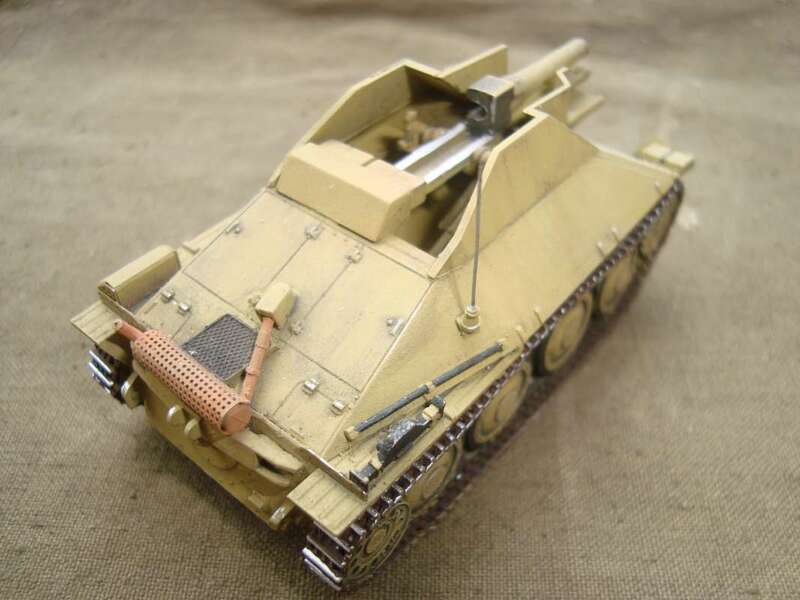 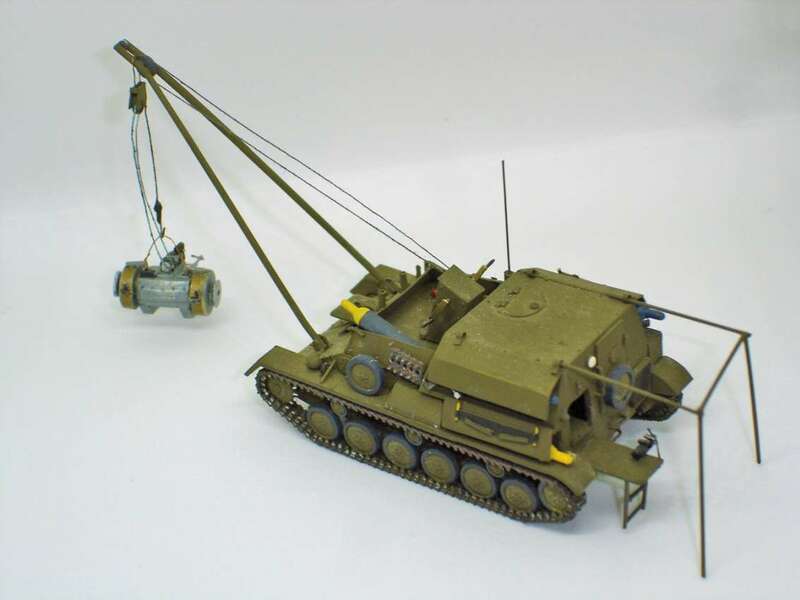 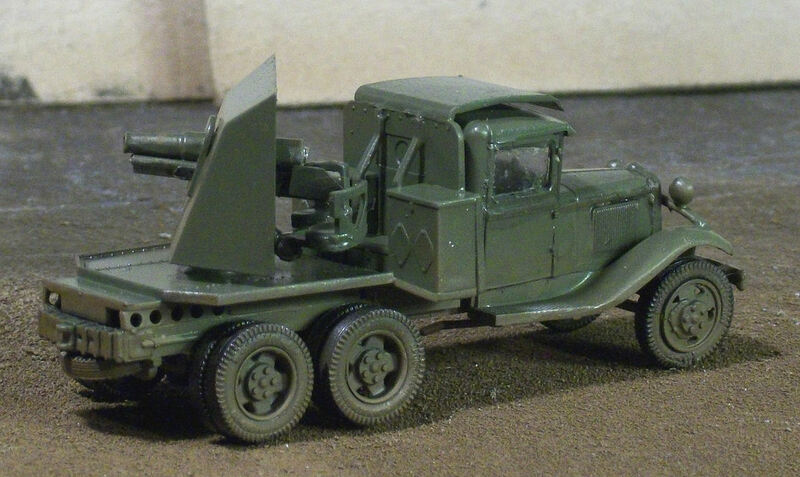 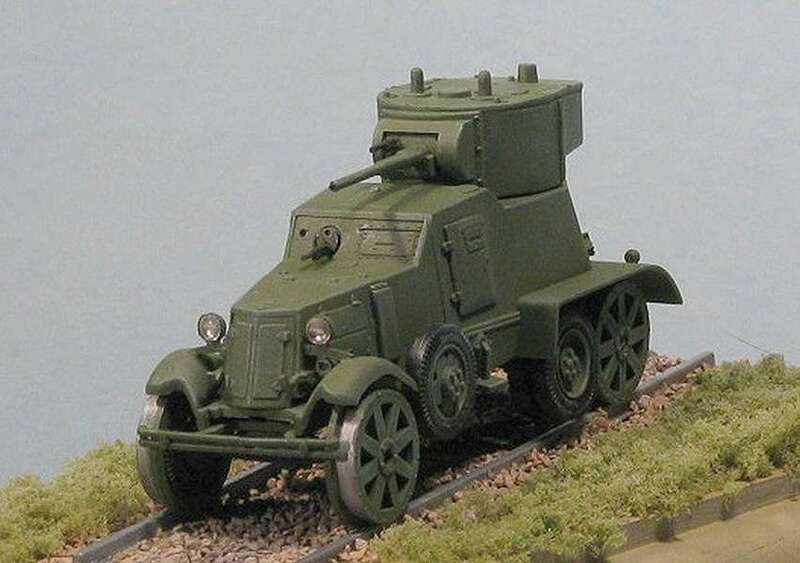 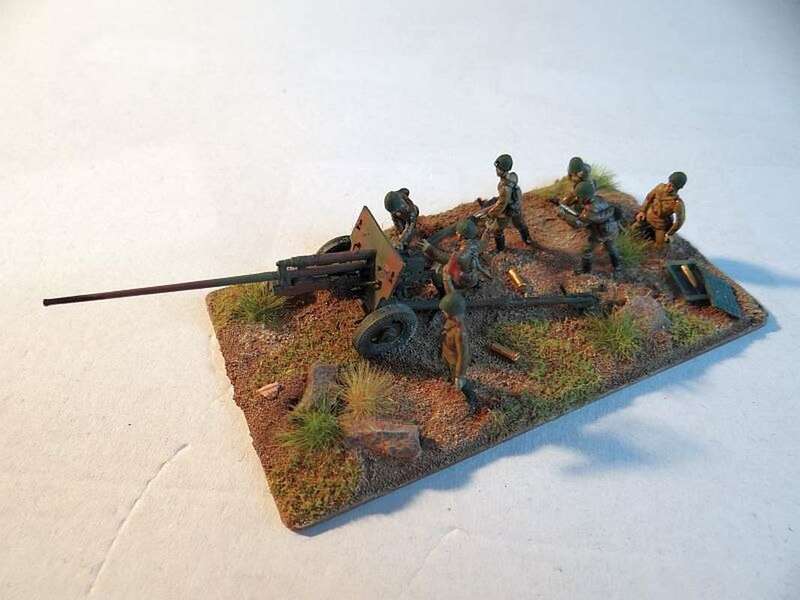 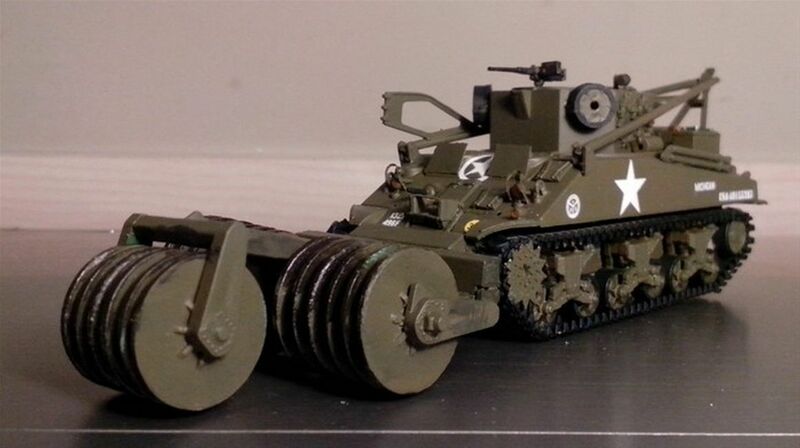 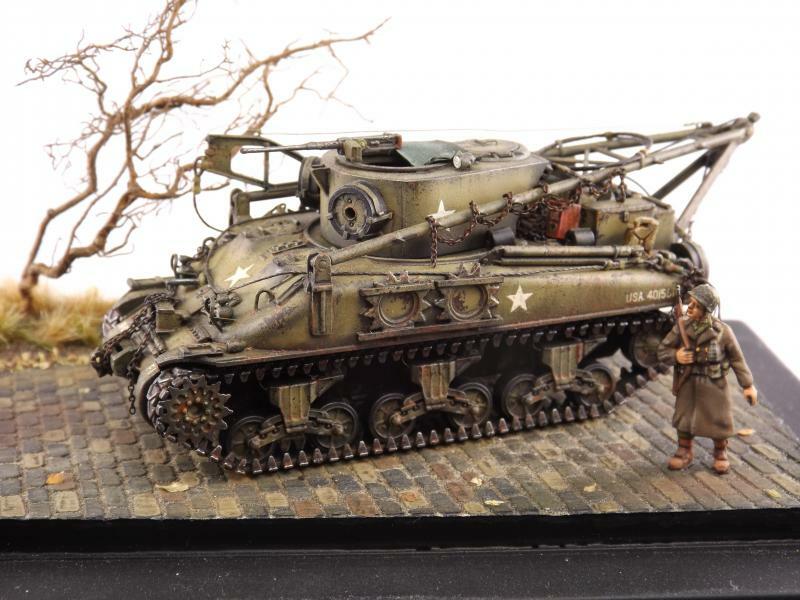 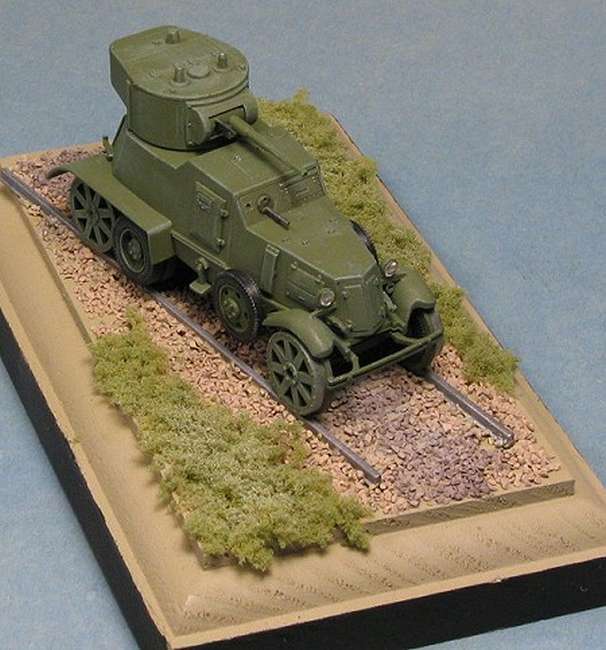 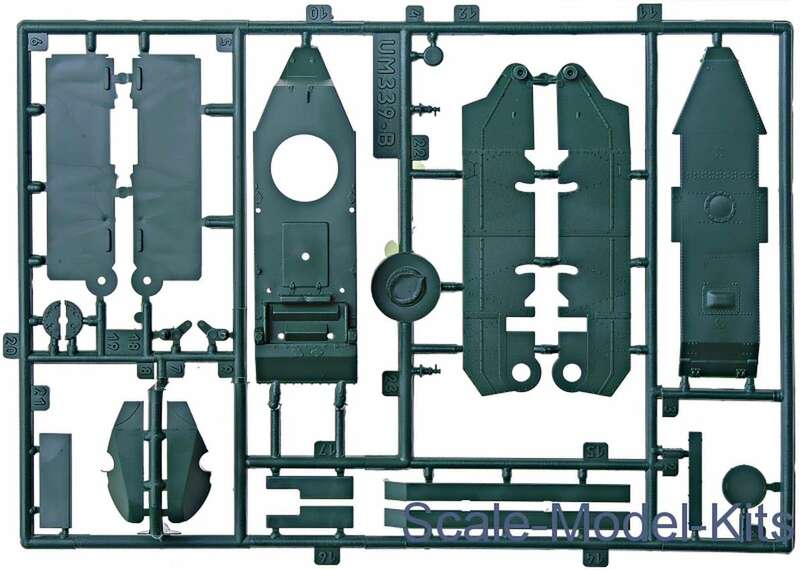 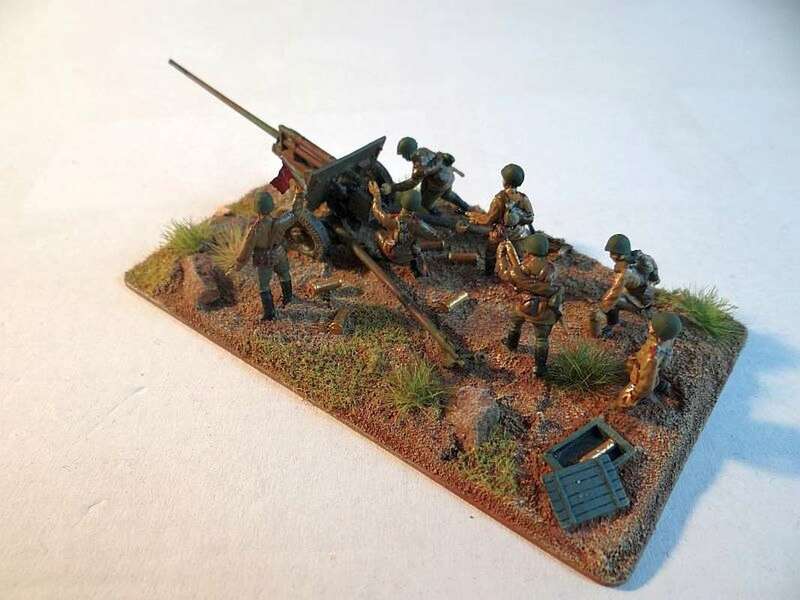 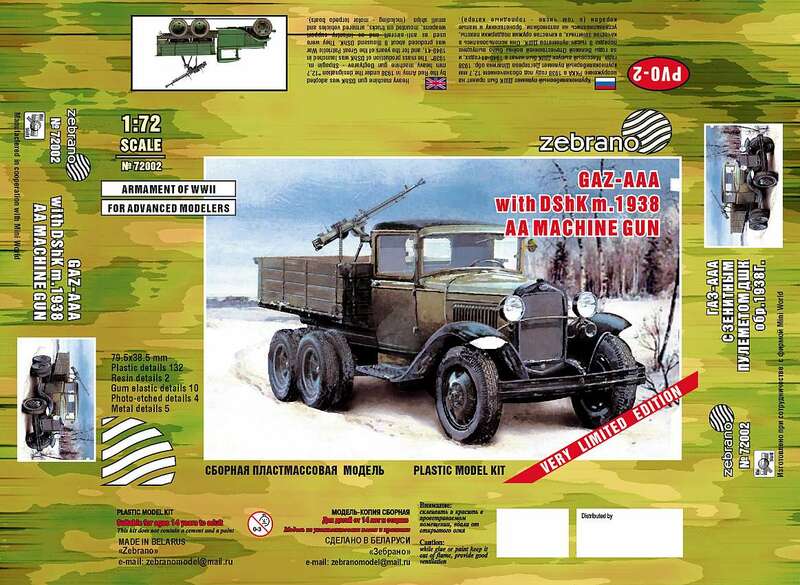 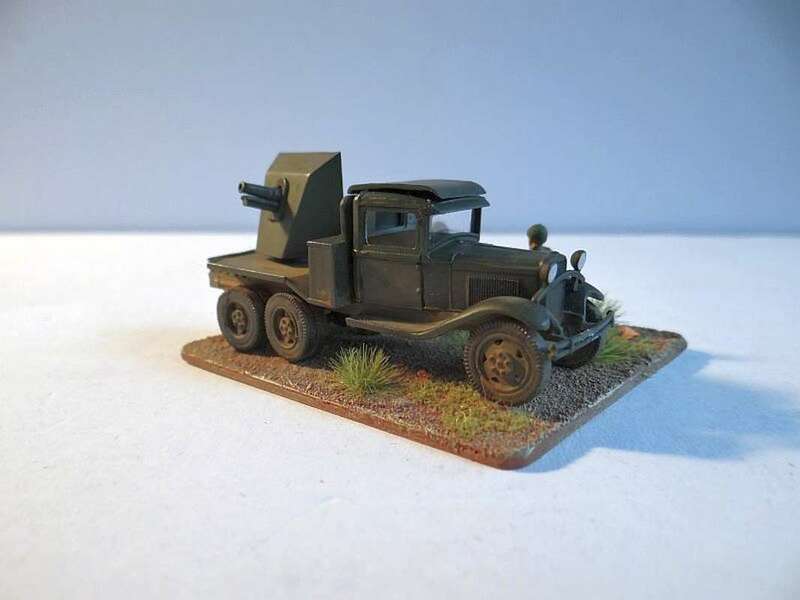 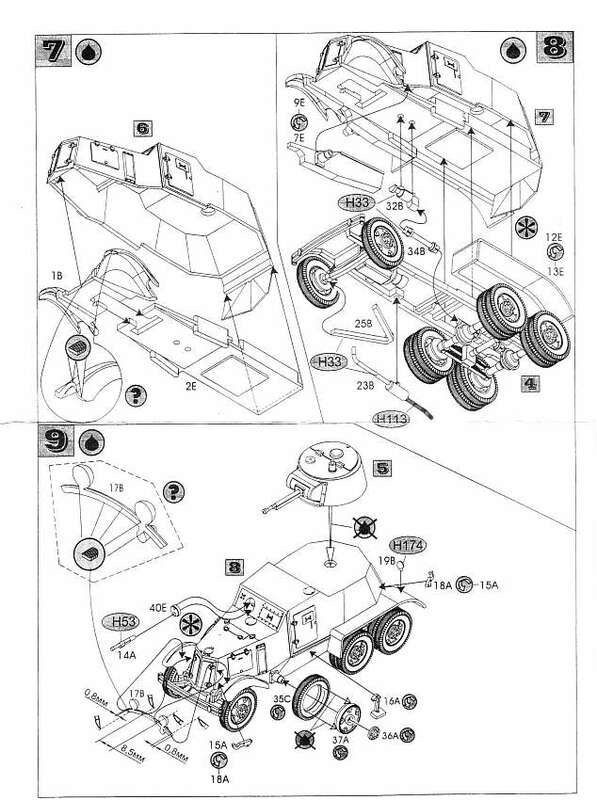 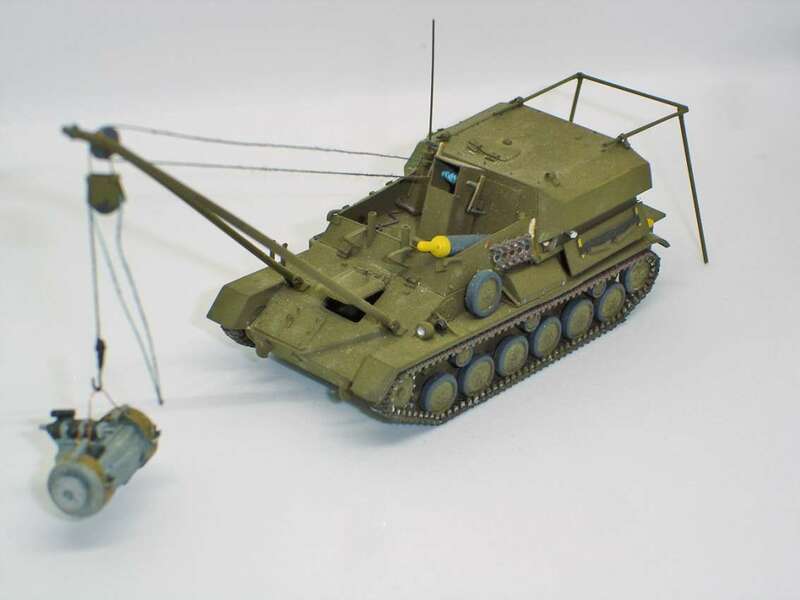 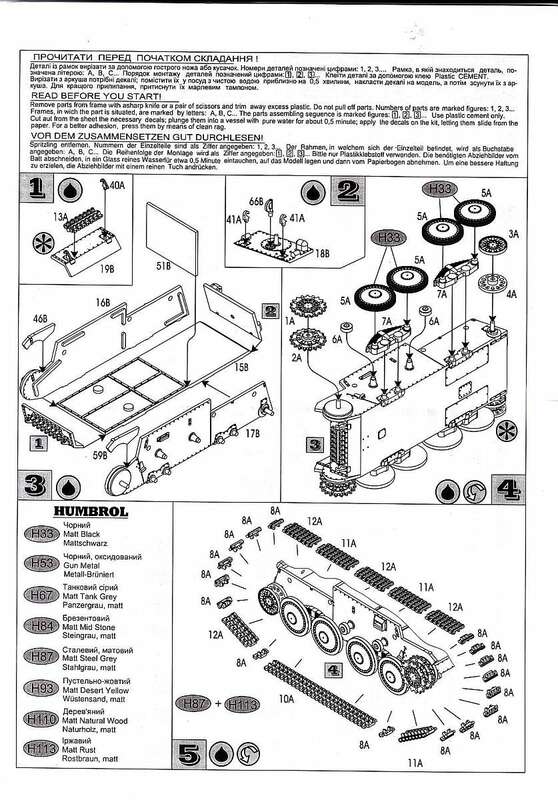 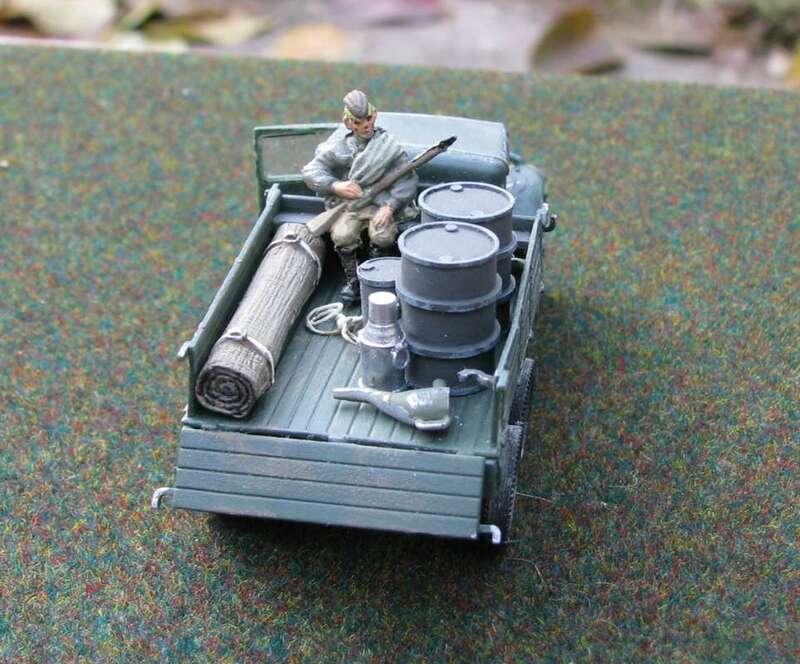 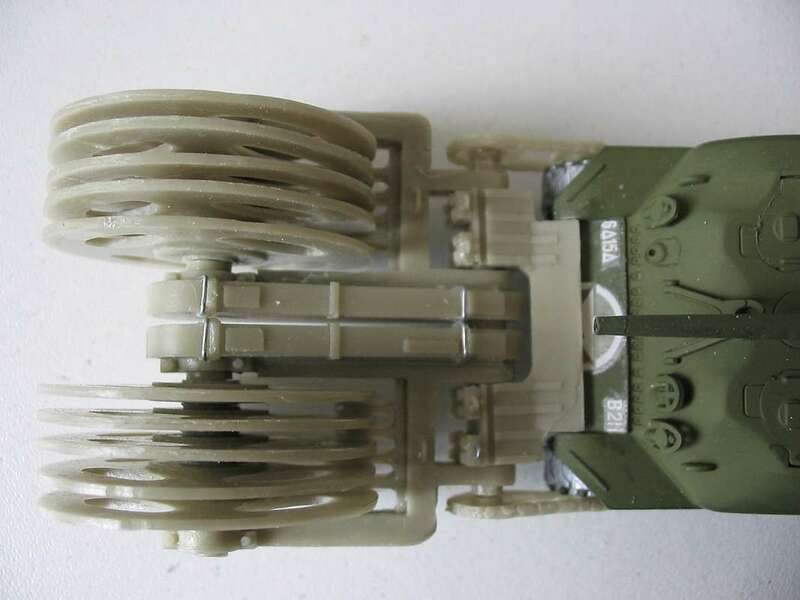 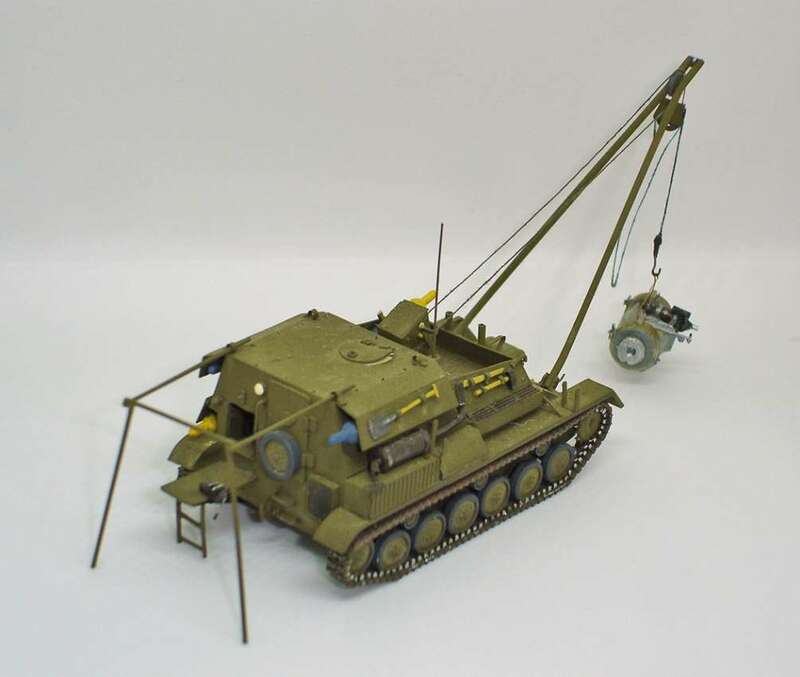 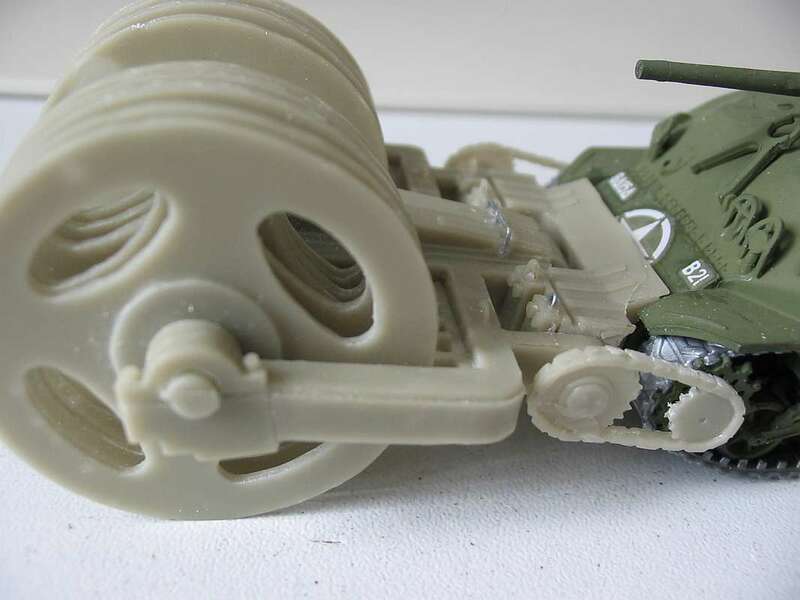 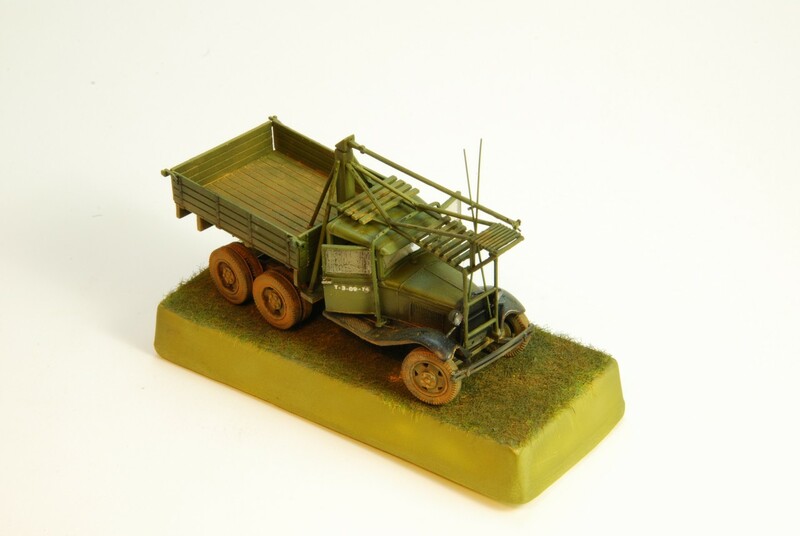 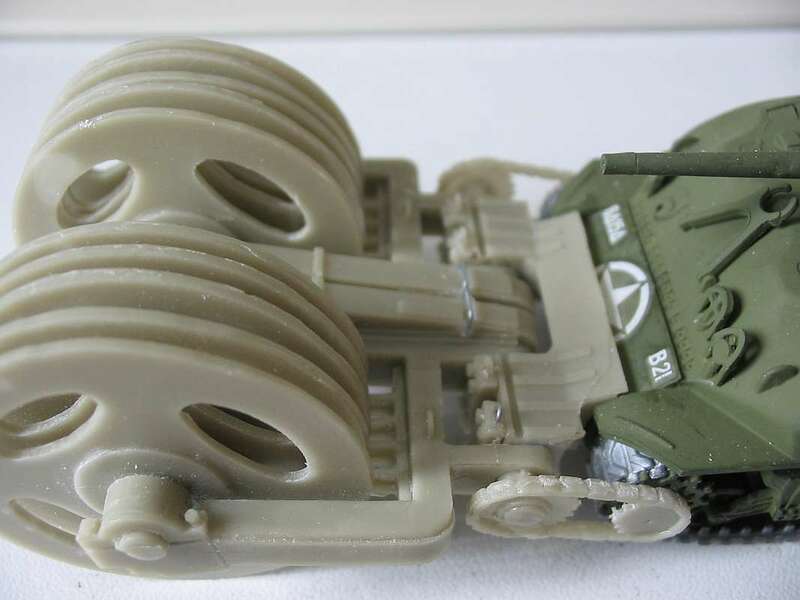 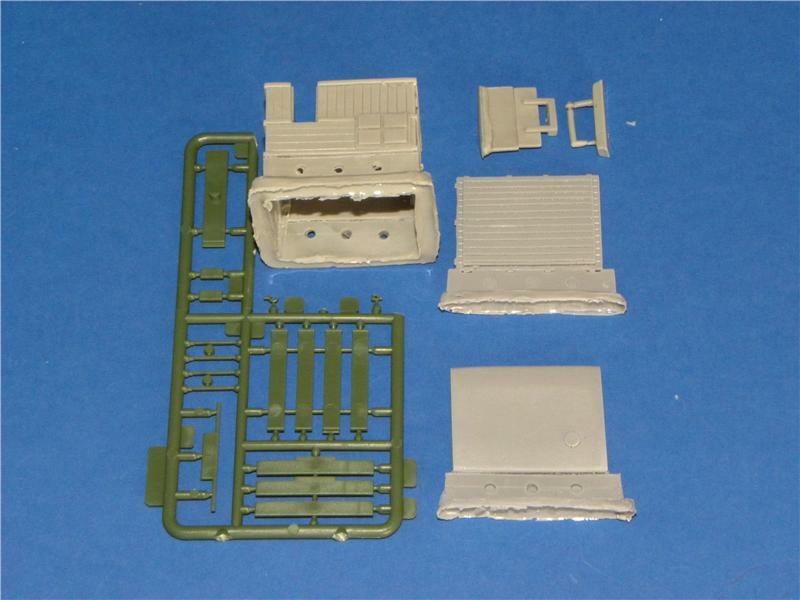 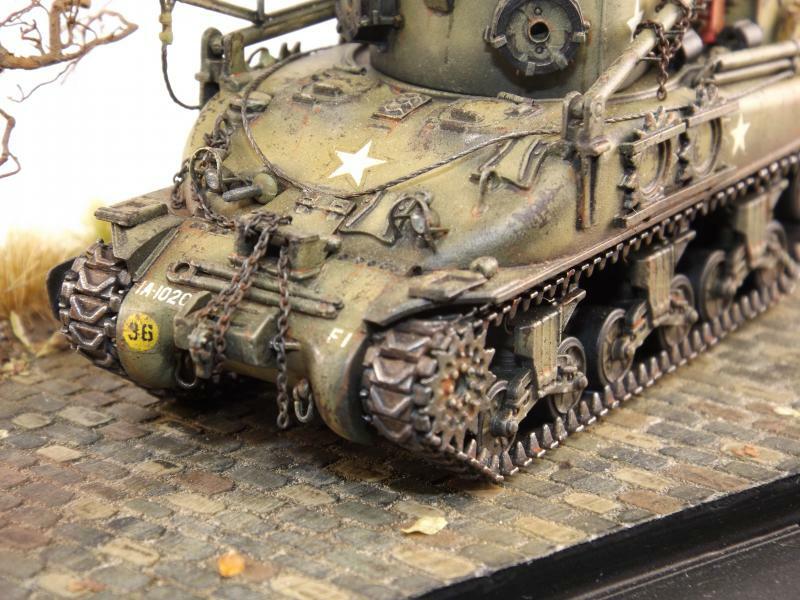 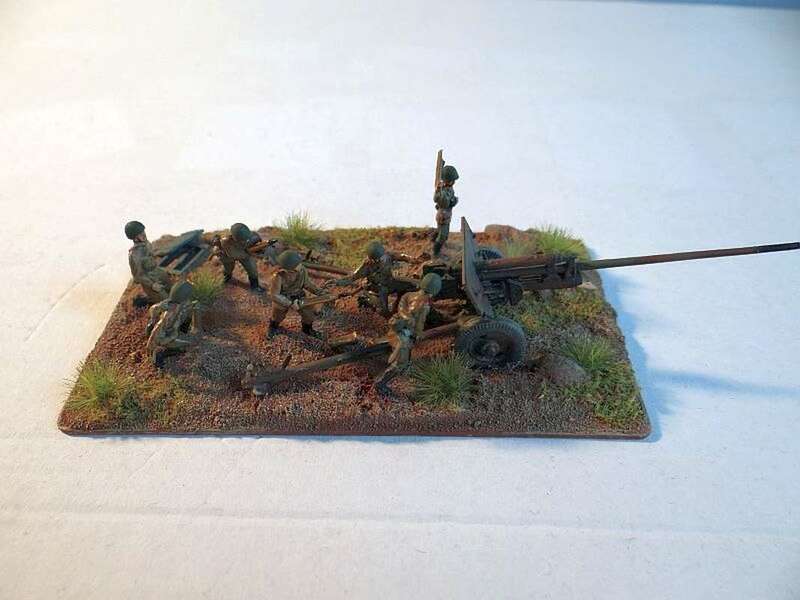 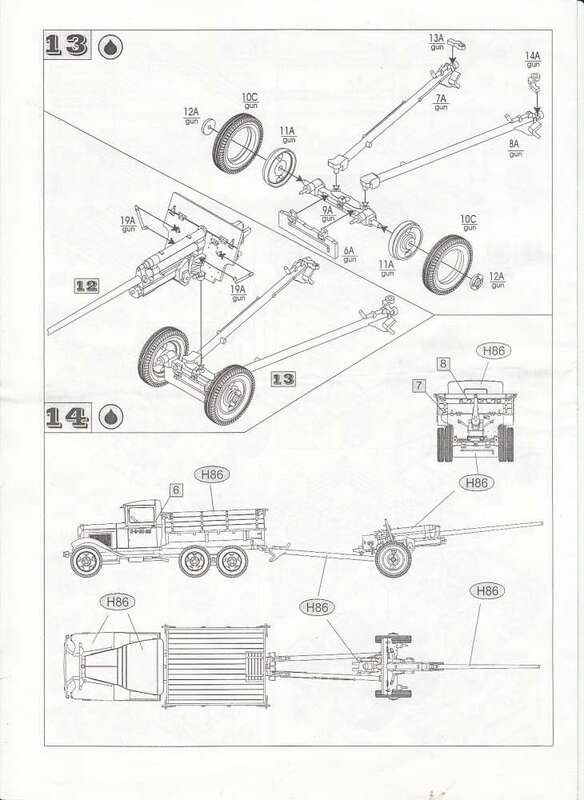 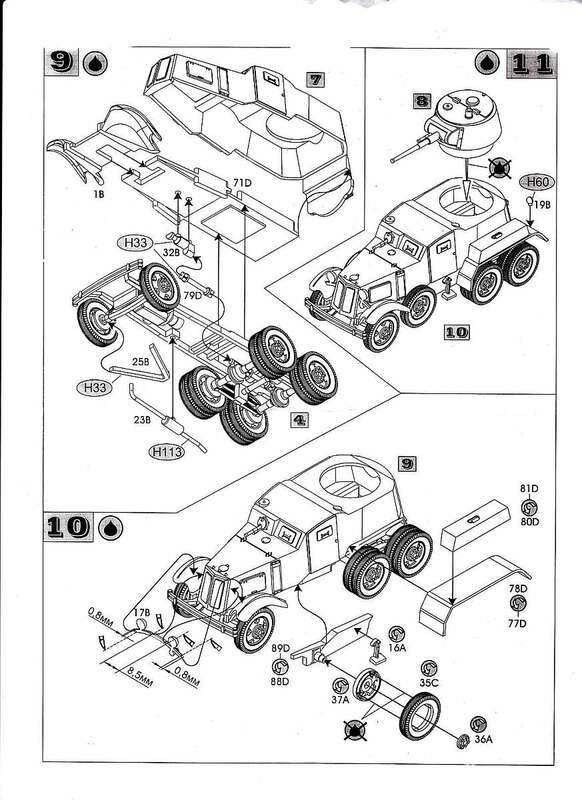 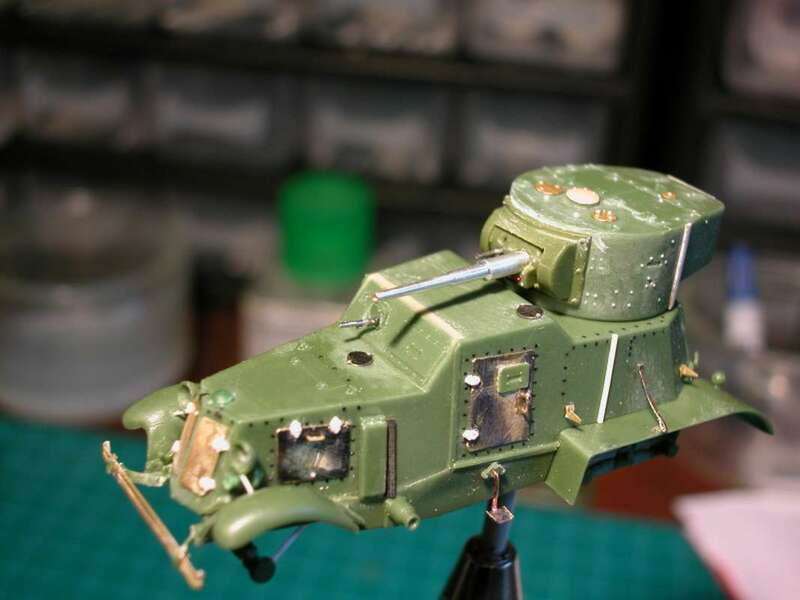 All road wheels and suspension arms are separate mouldings, the gun and turret are designed to move and upper hull accessories include ammo boxes, lights, towing hook and a spare wheel. 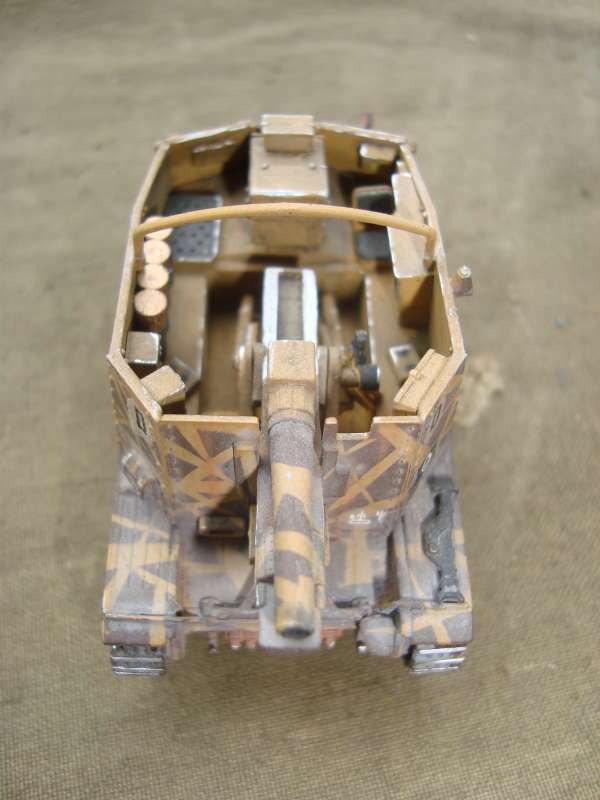 While there is no interior detail there are optional position hatched in the turret and at the front of the upper hull. 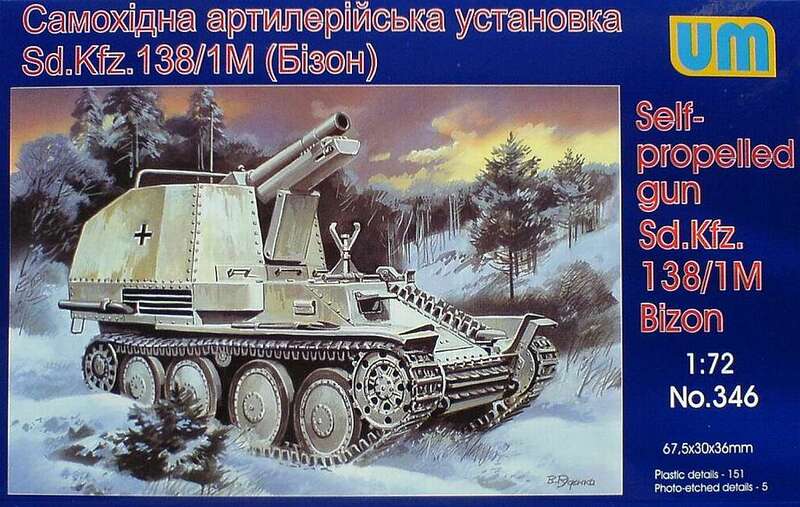 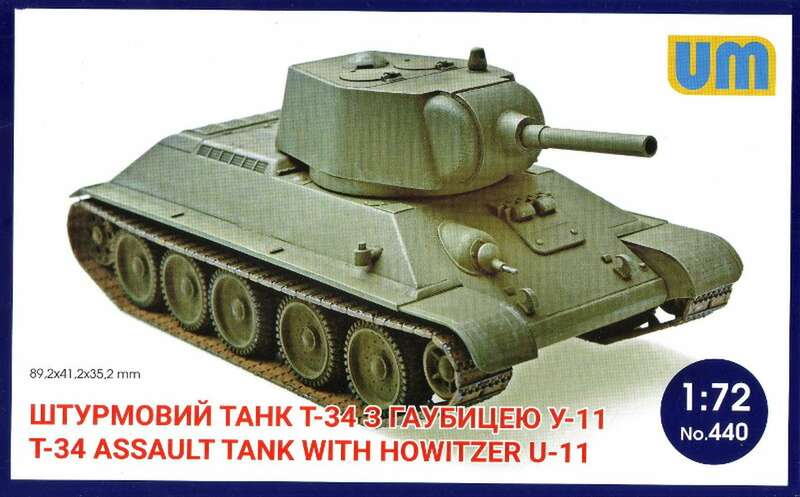 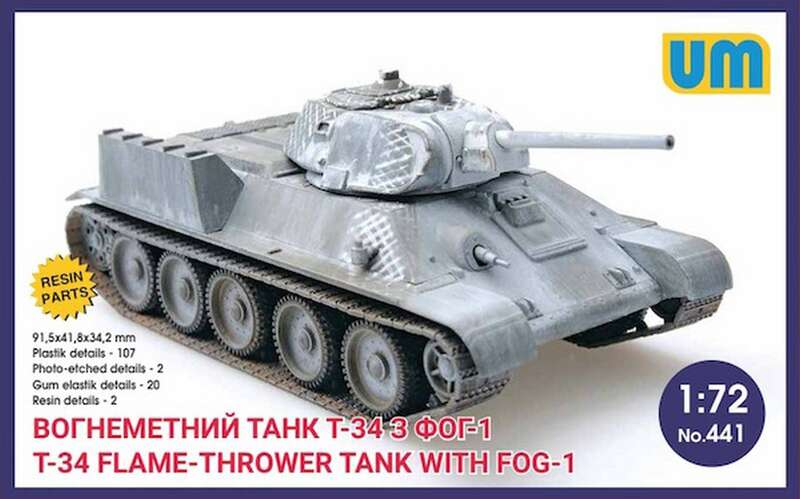 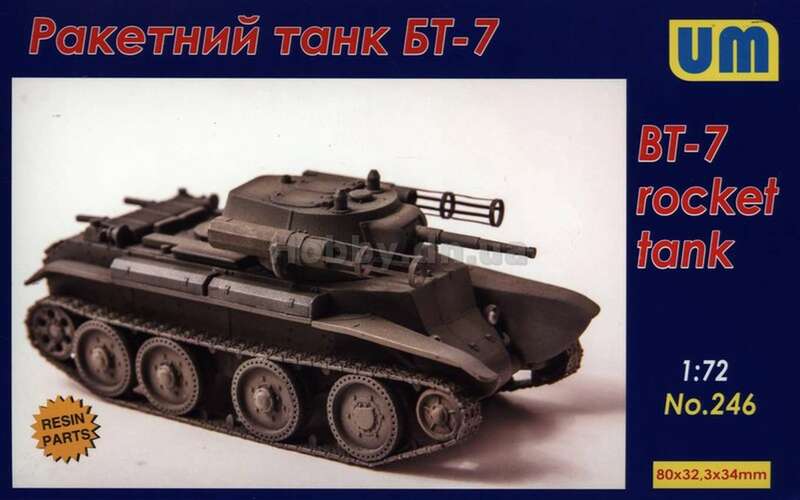 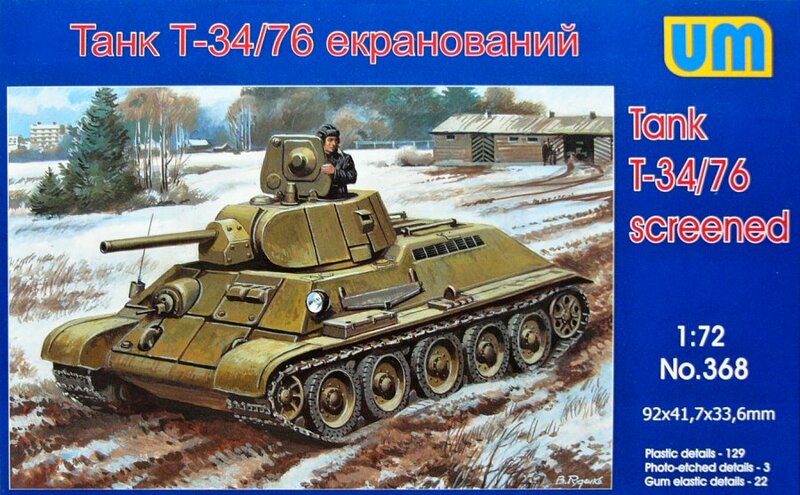 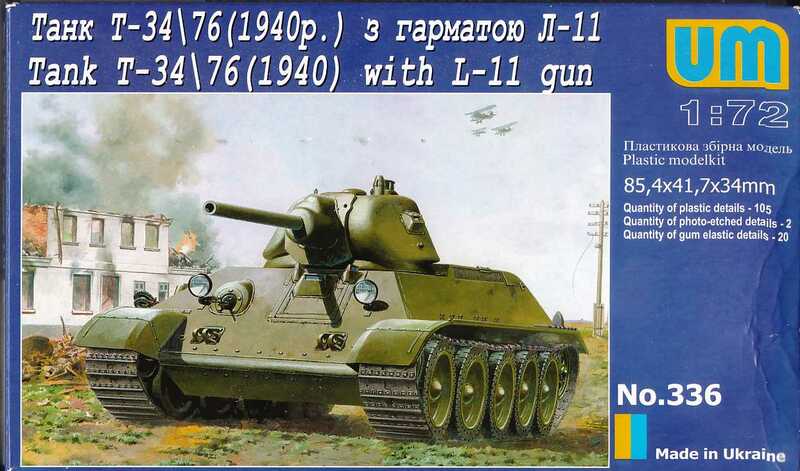 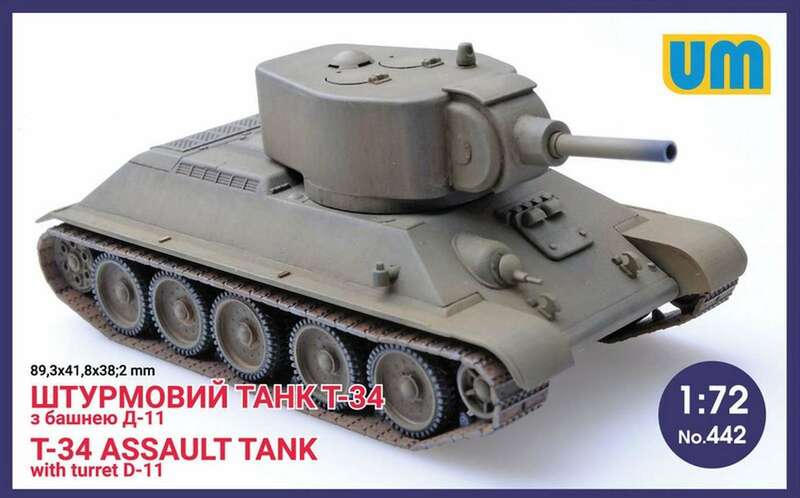 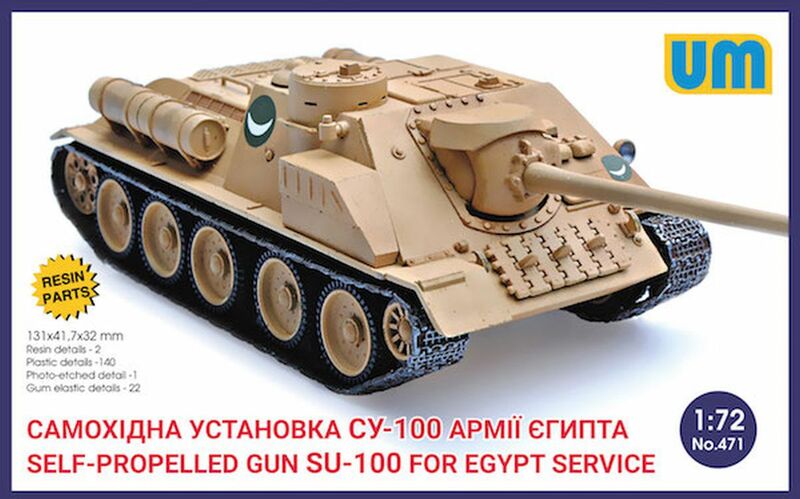 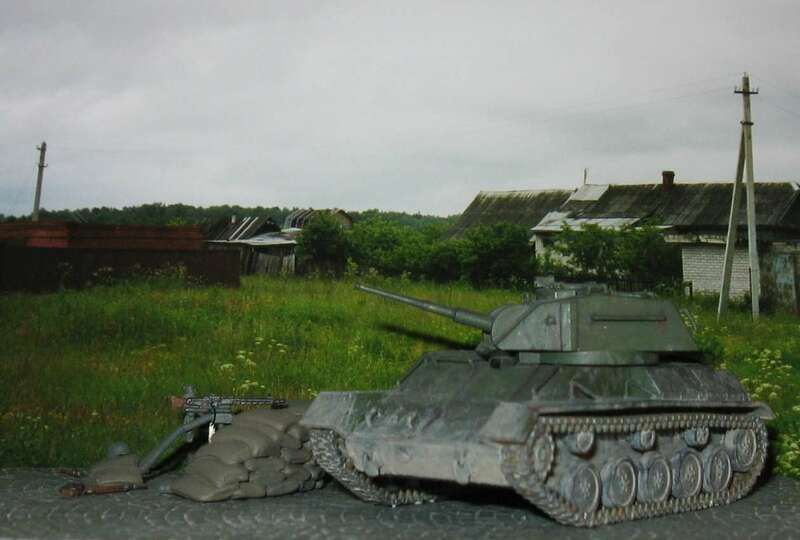 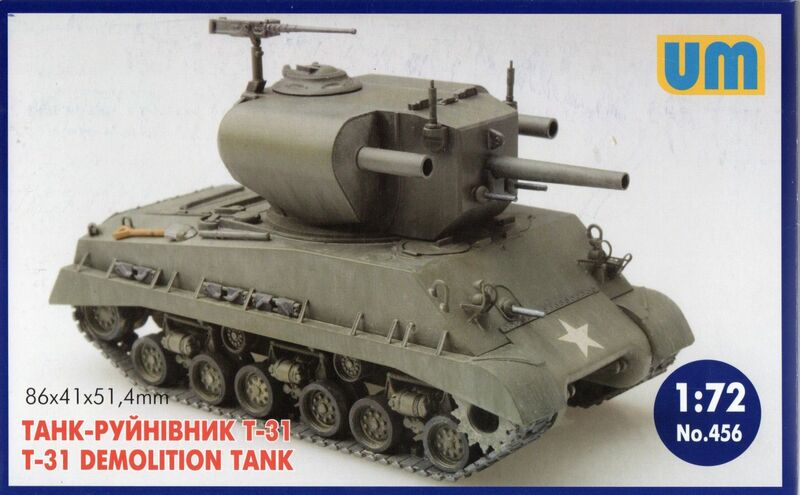 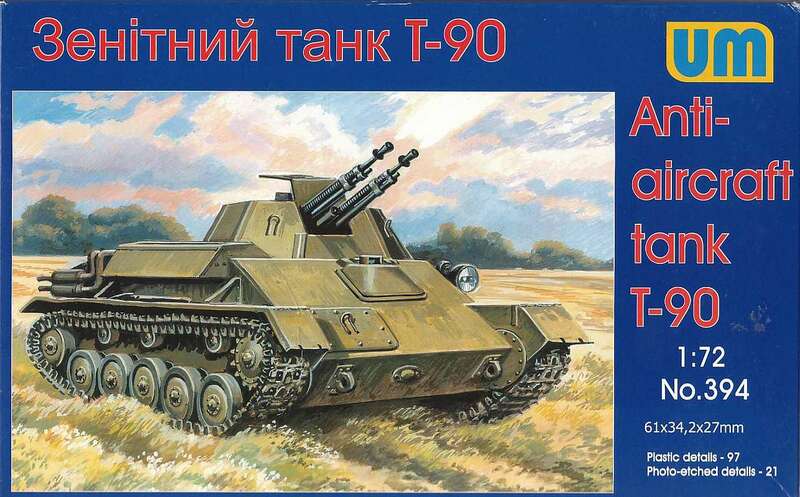 Virtually the same kit as the T-70M but with a larger (two hatch) turret and gun...and different decals. 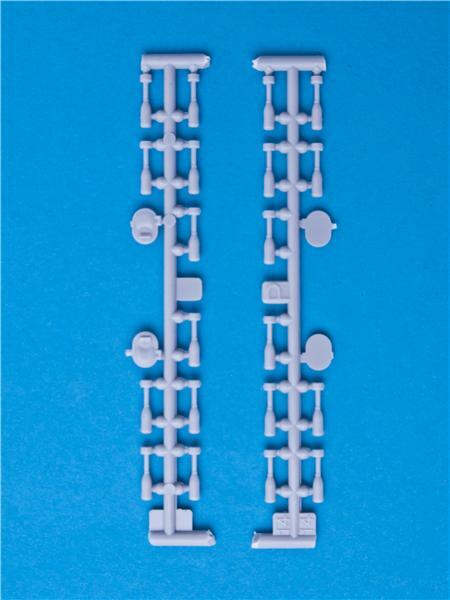 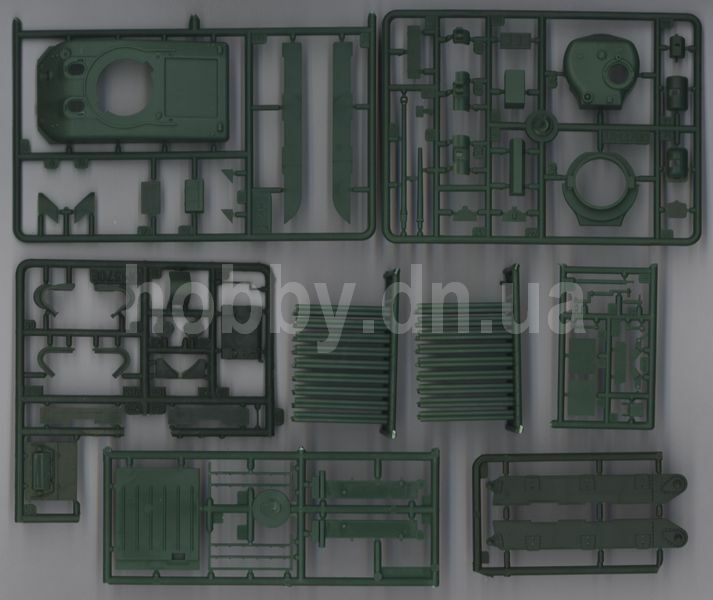 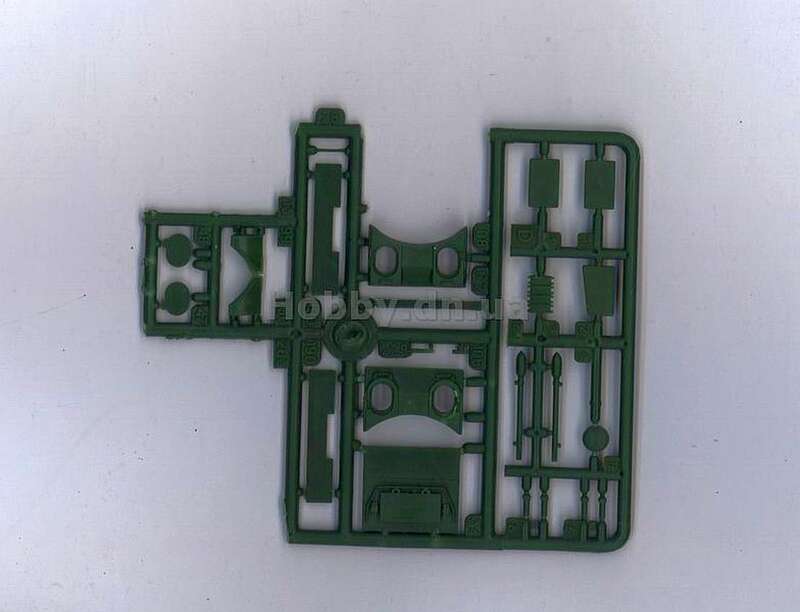 As with the T-70 there are 107 'long run' injection moulded parts (including 'link and length' tracks) with fine raised detail. 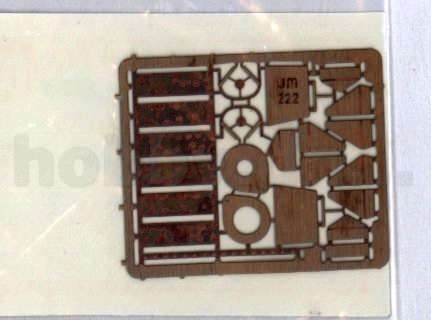 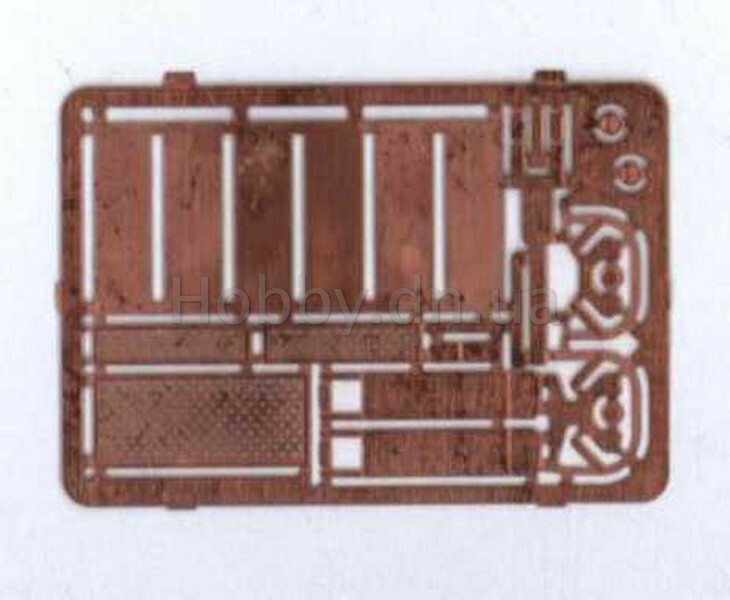 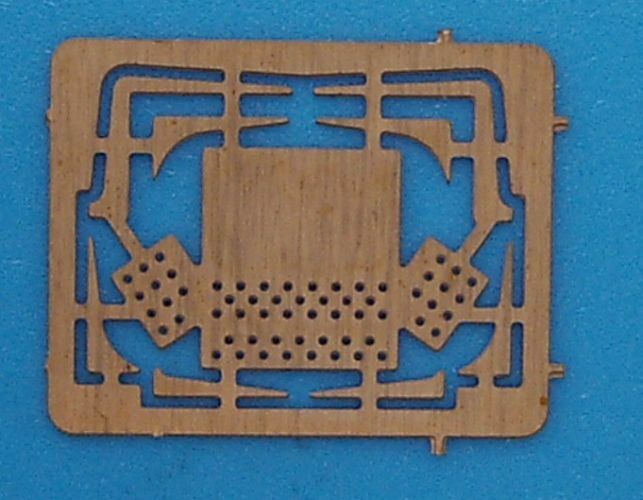 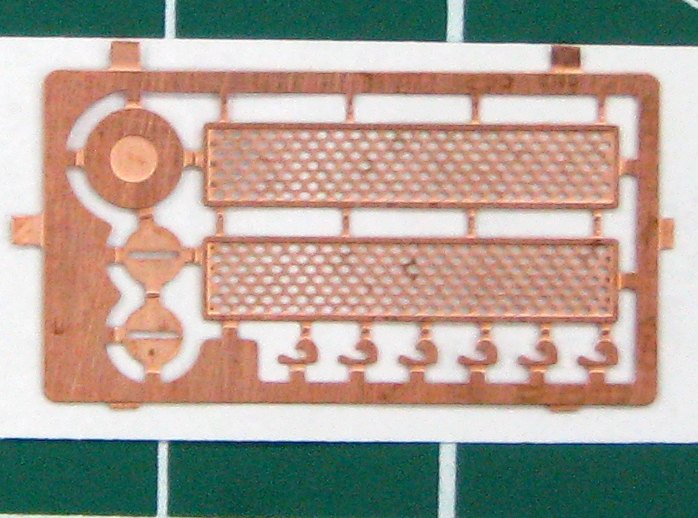 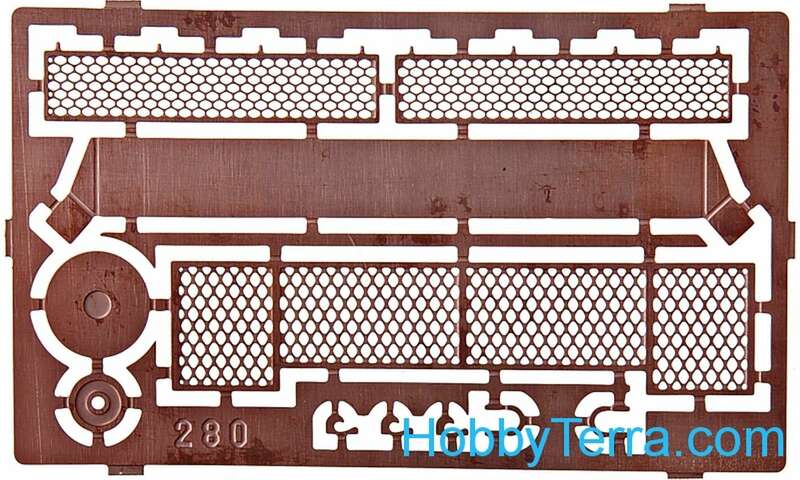 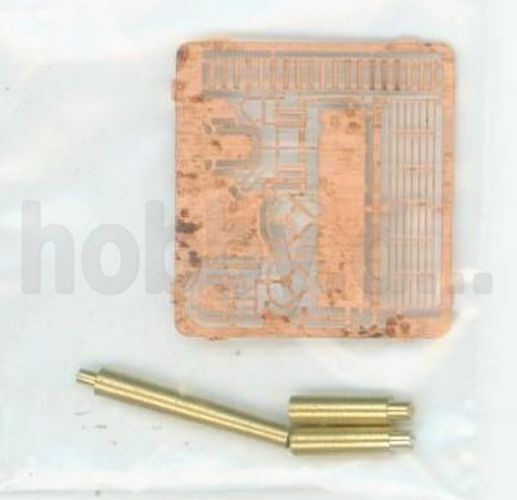 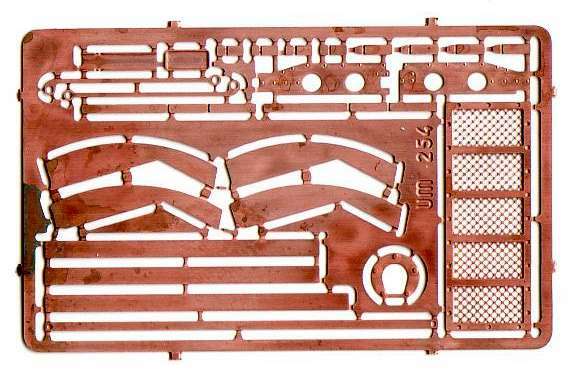 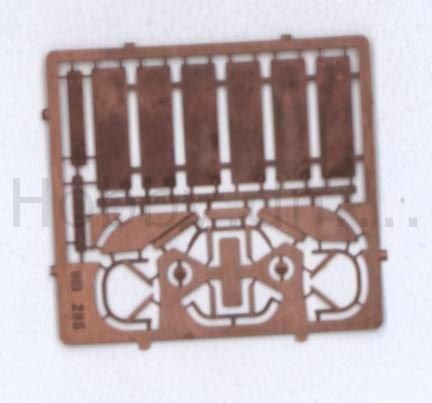 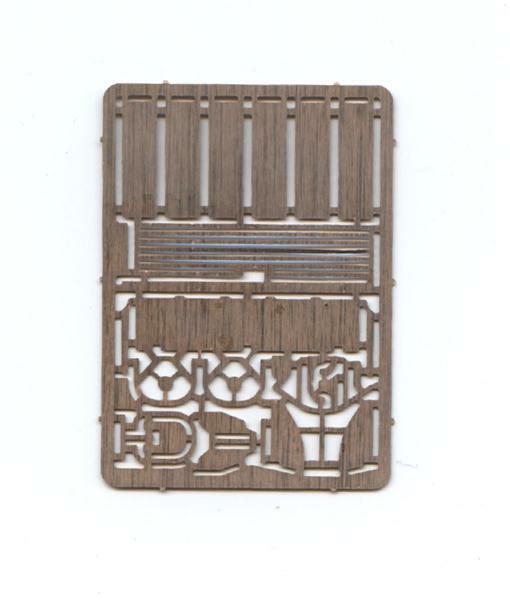 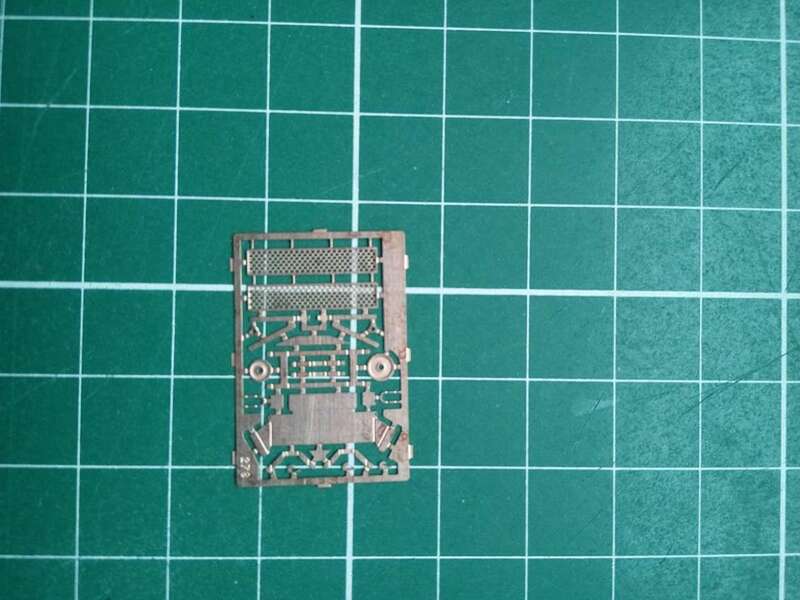 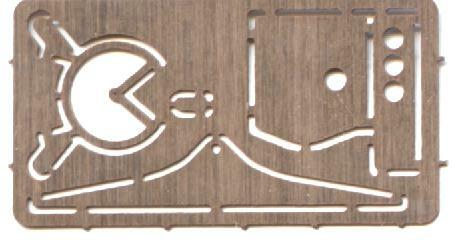 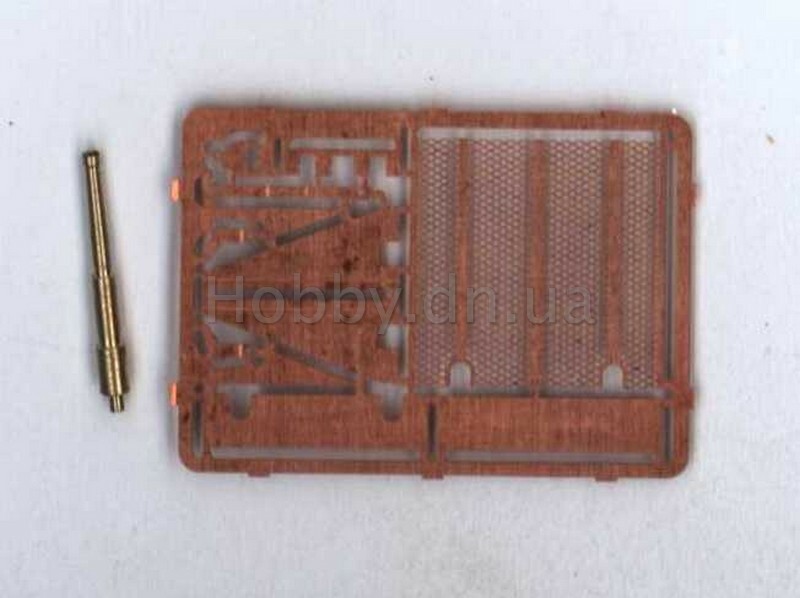 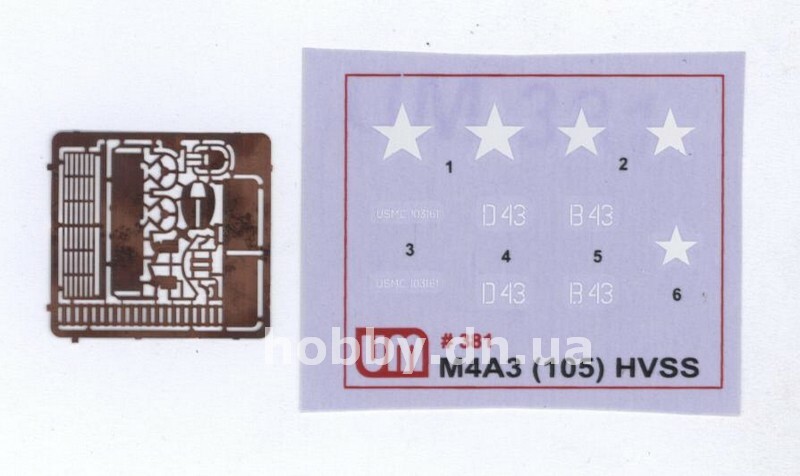 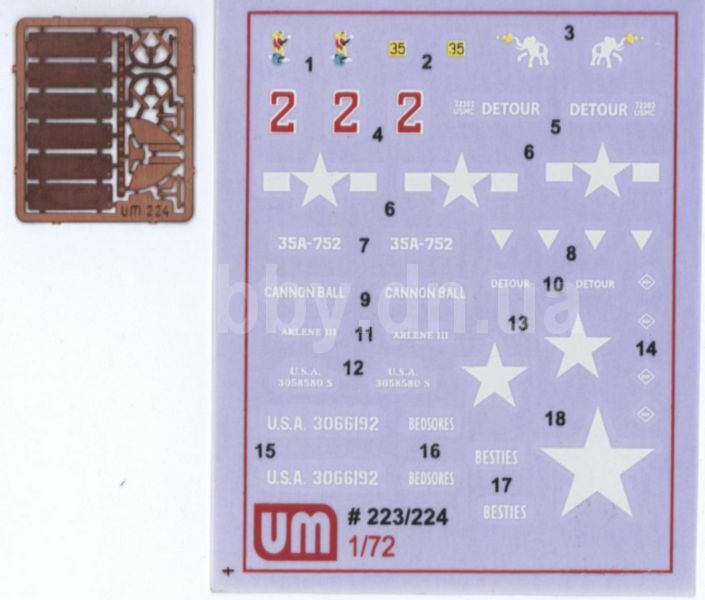 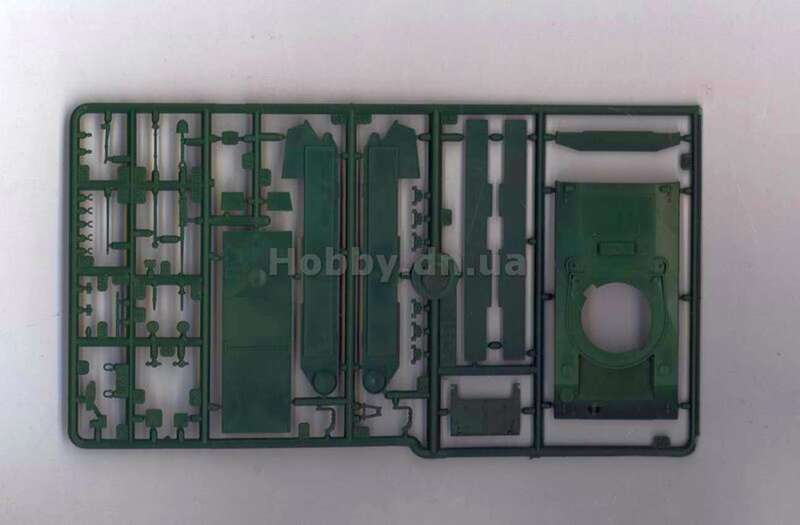 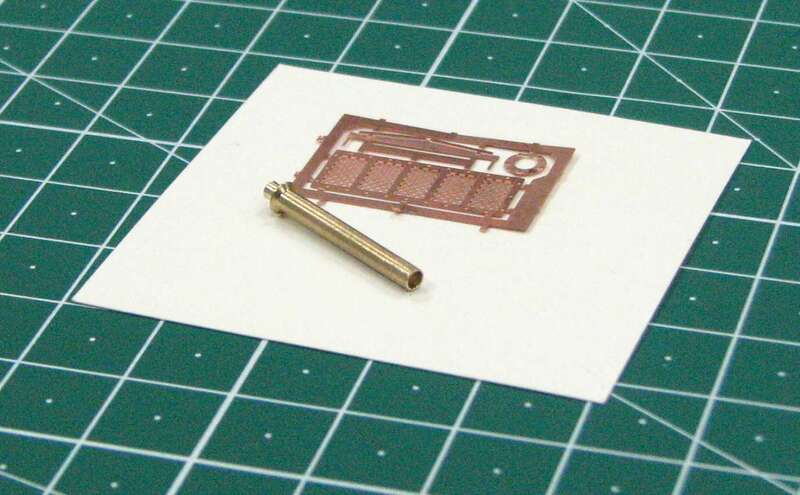 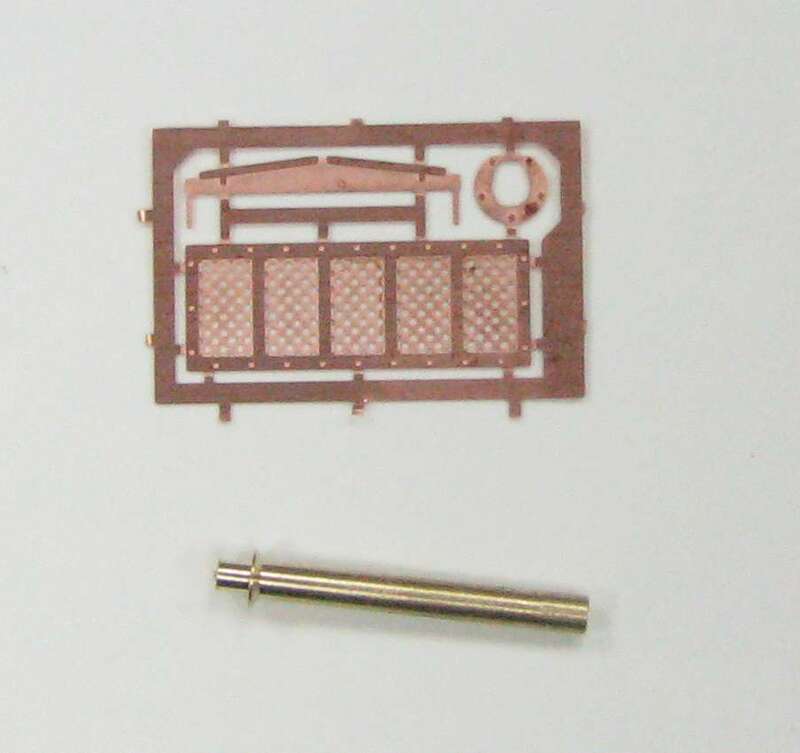 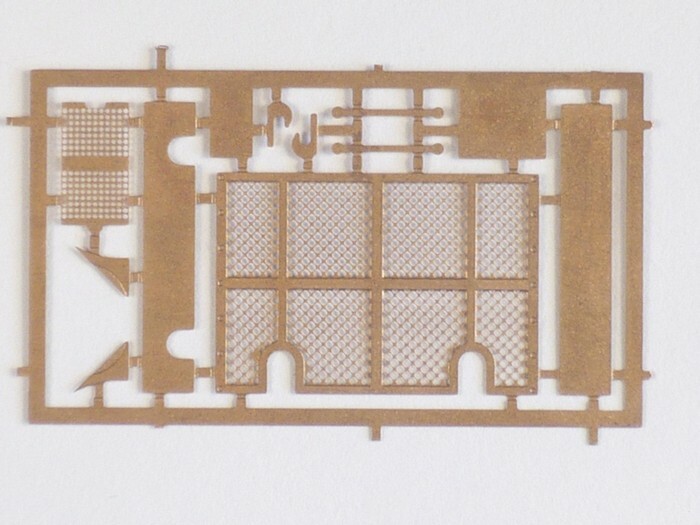 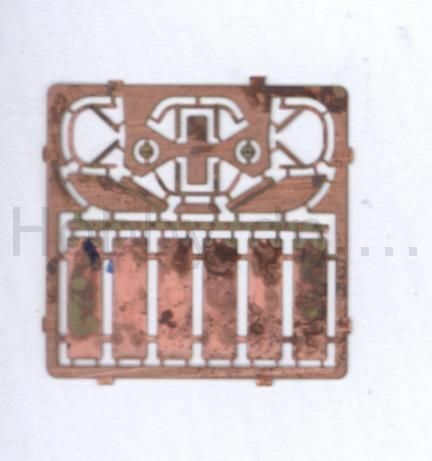 There's also a small fret of photo etched parts. 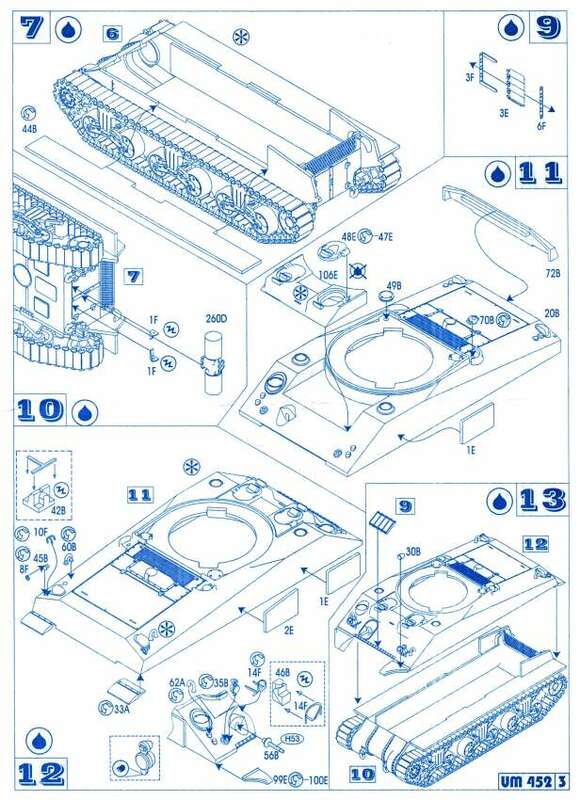 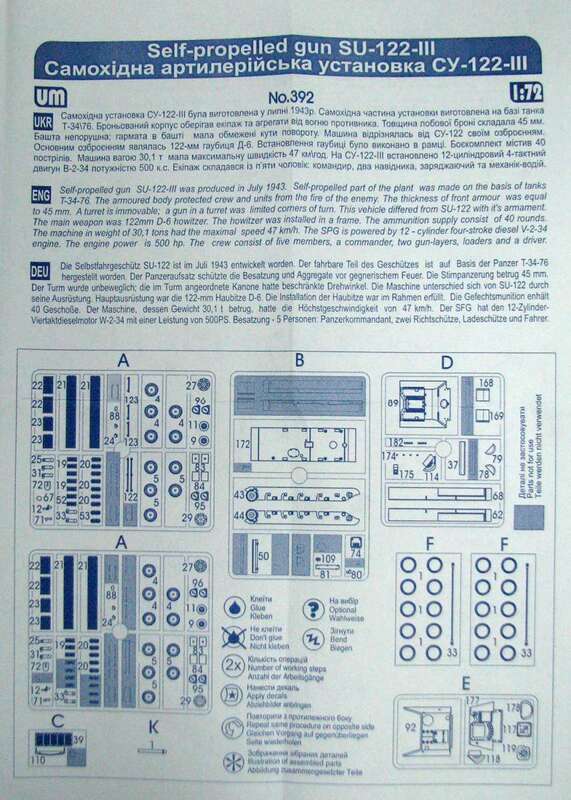 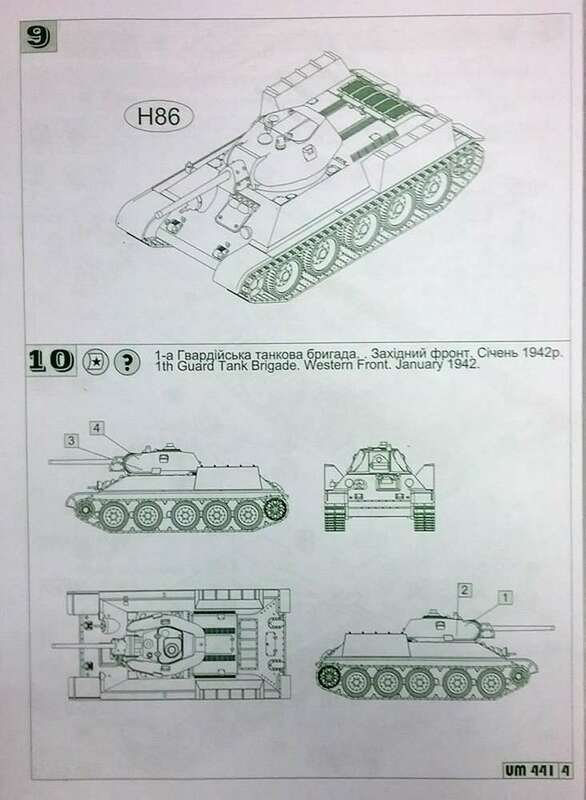 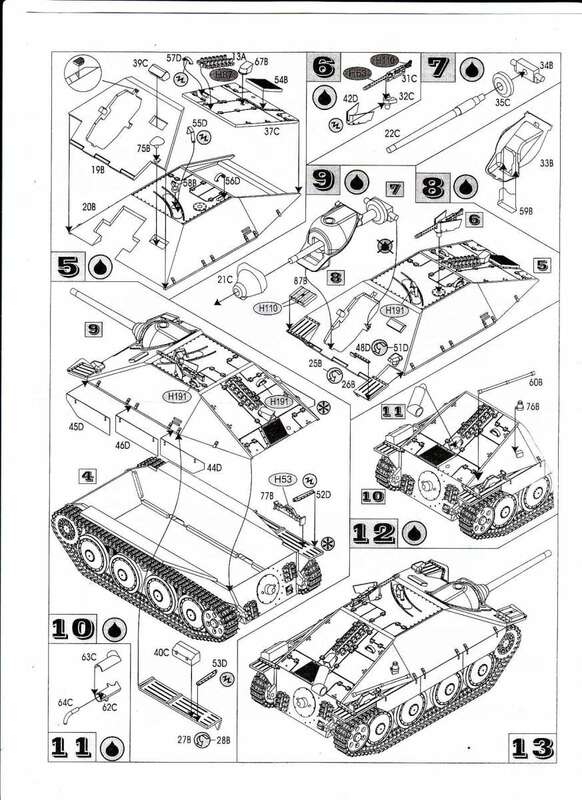 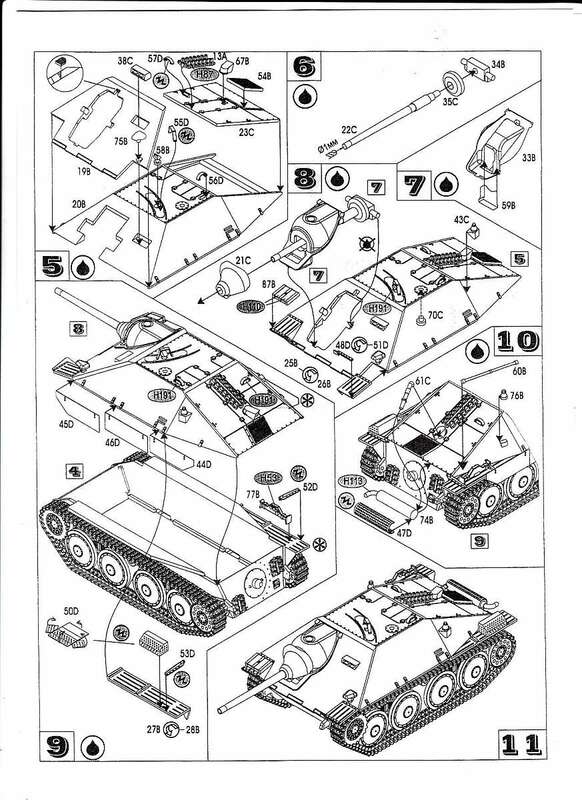 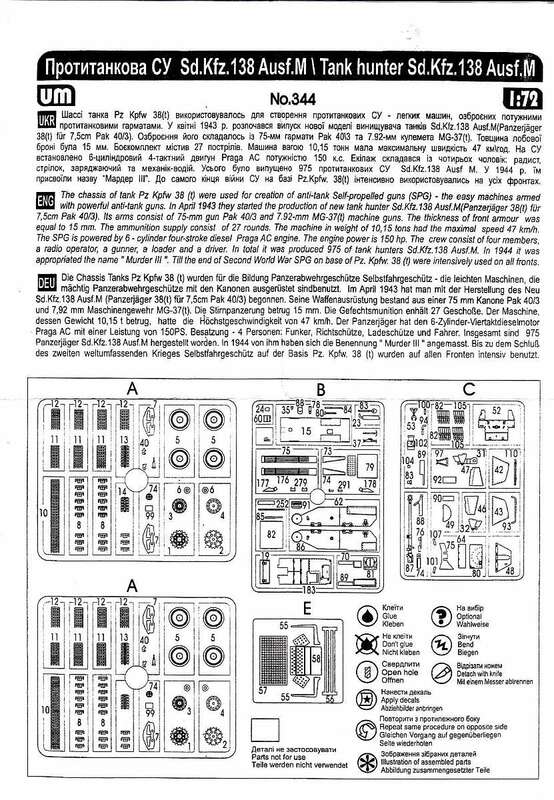 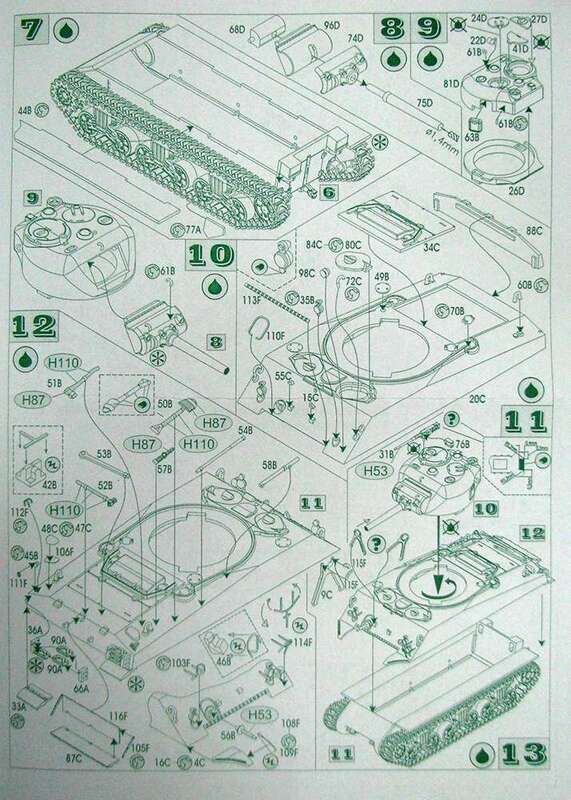 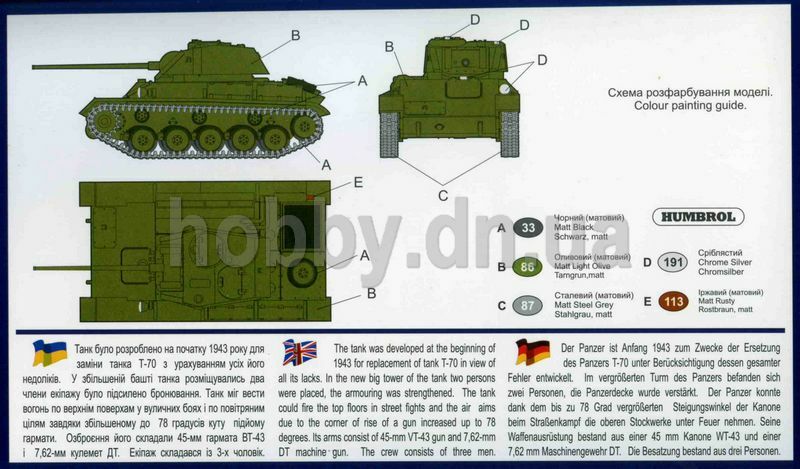 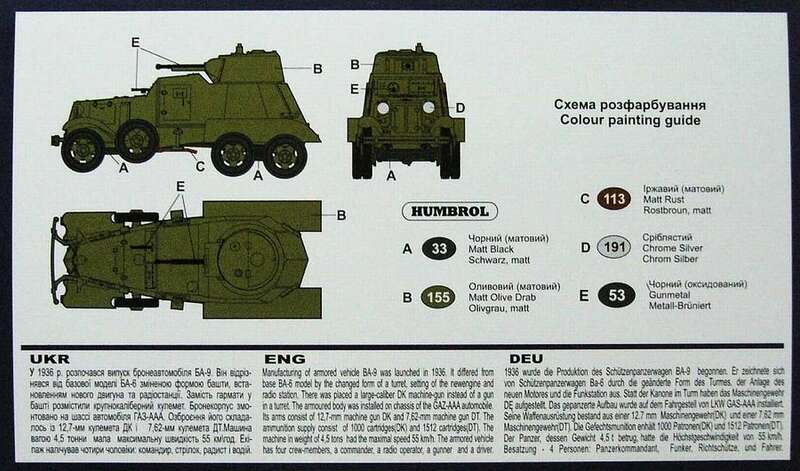 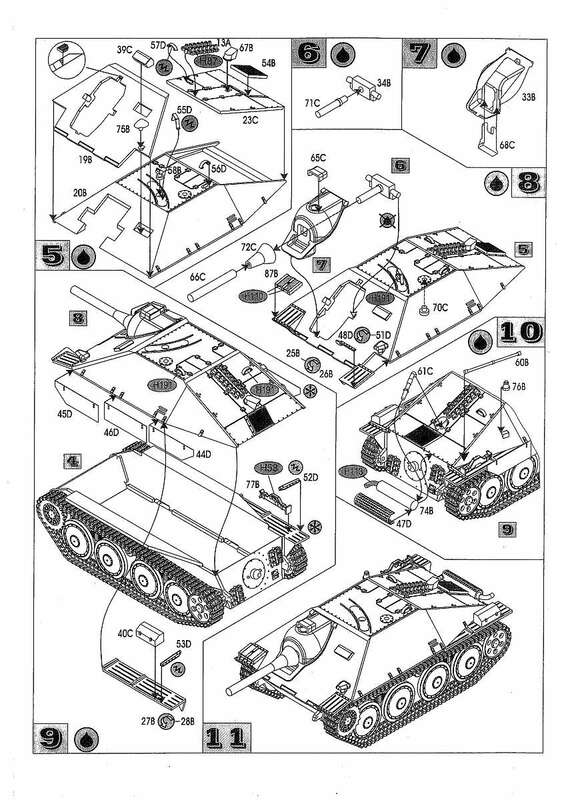 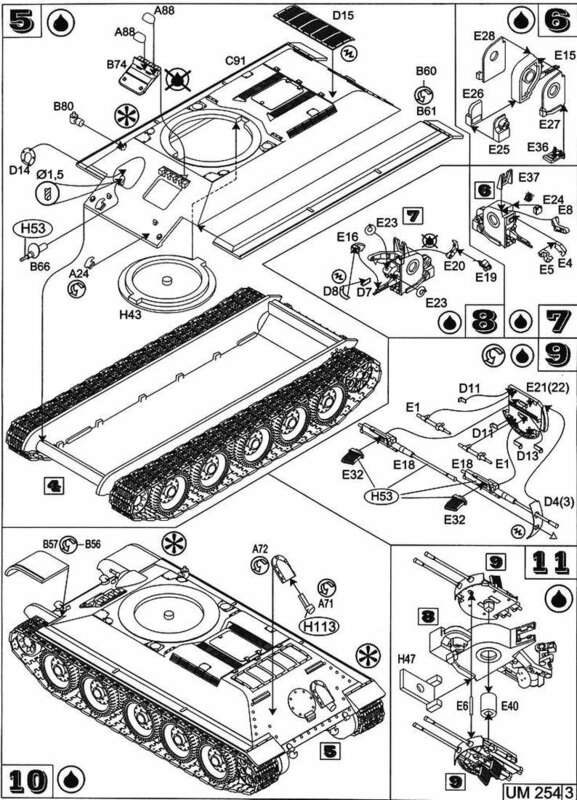 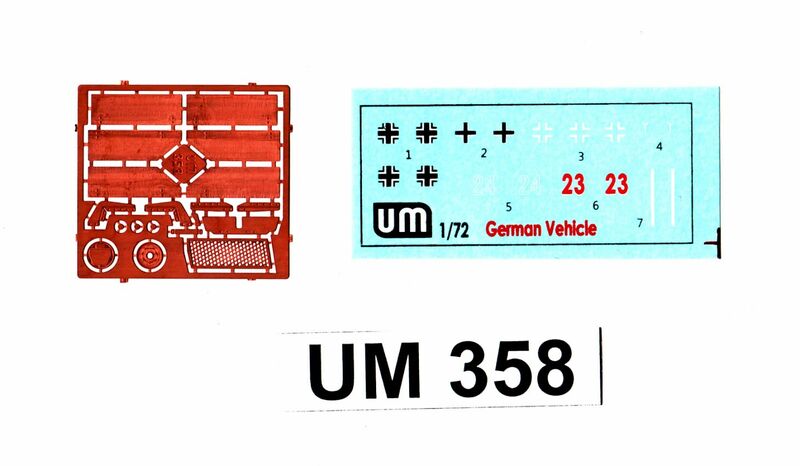 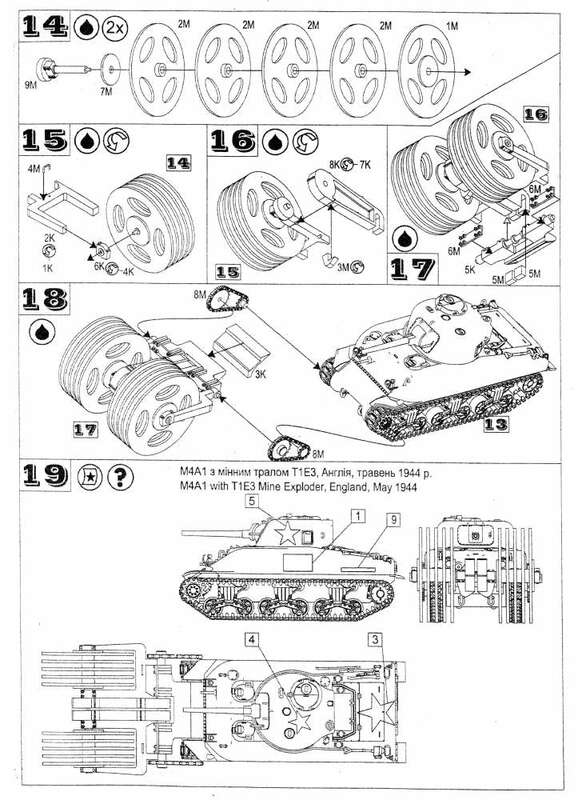 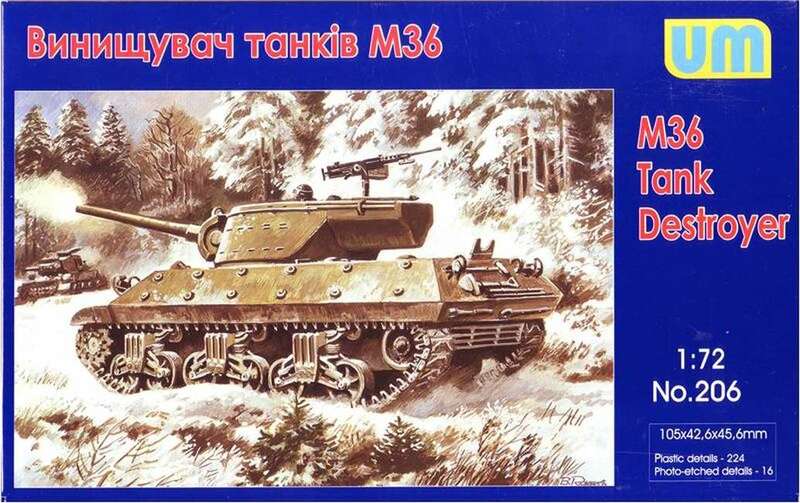 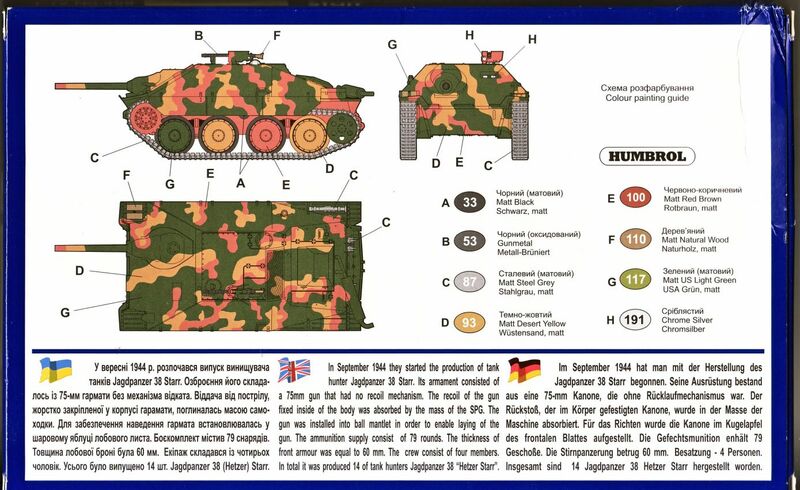 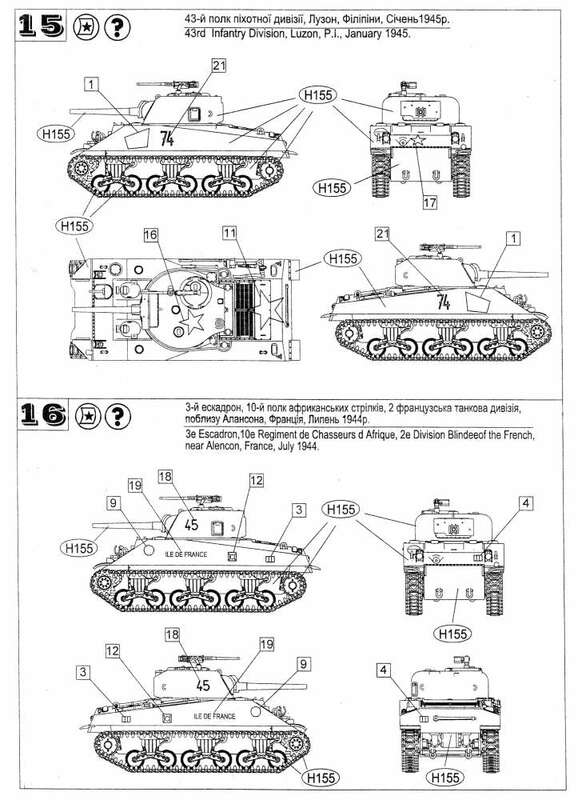 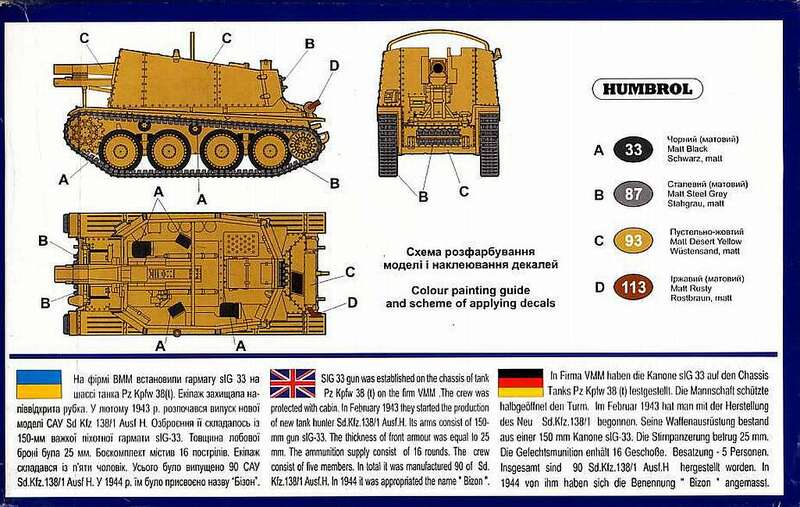 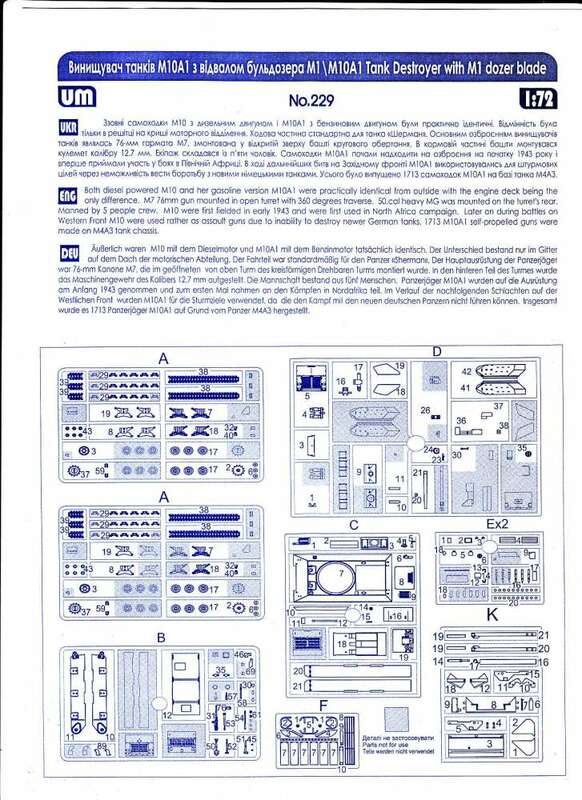 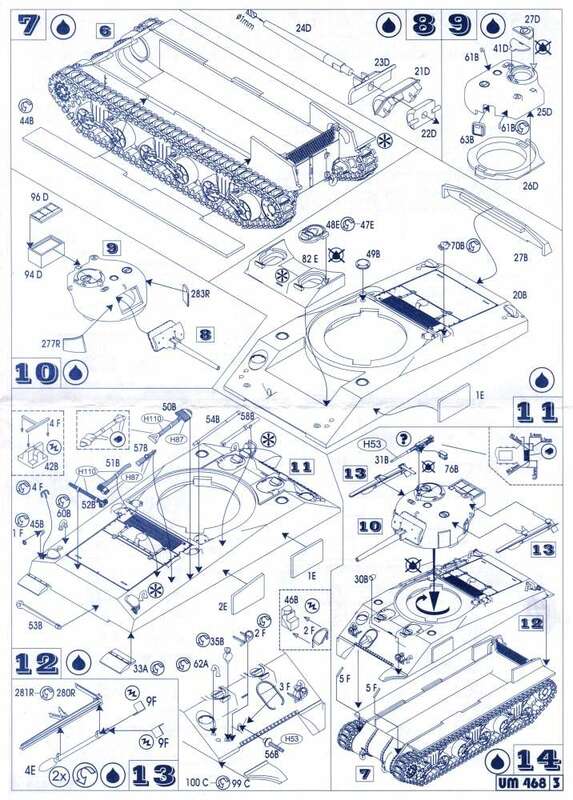 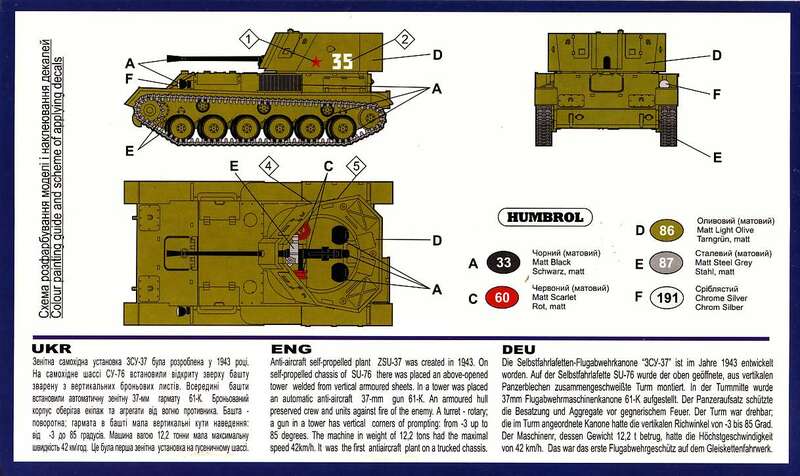 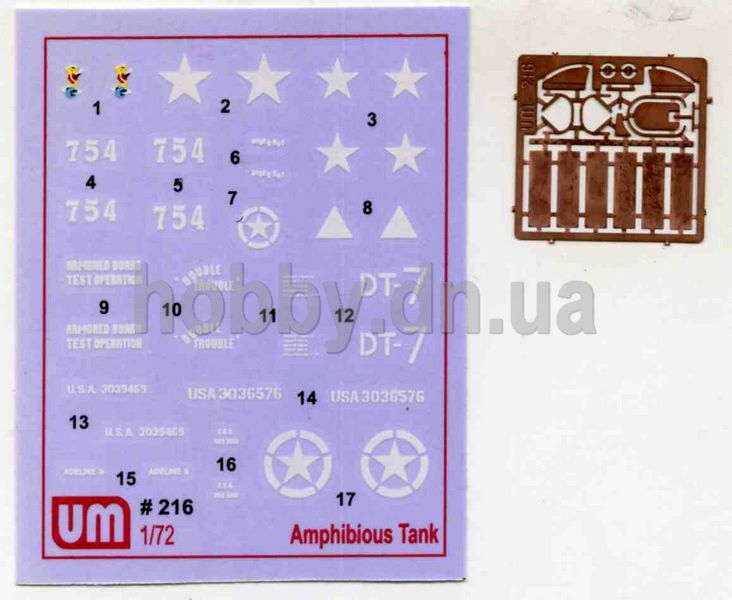 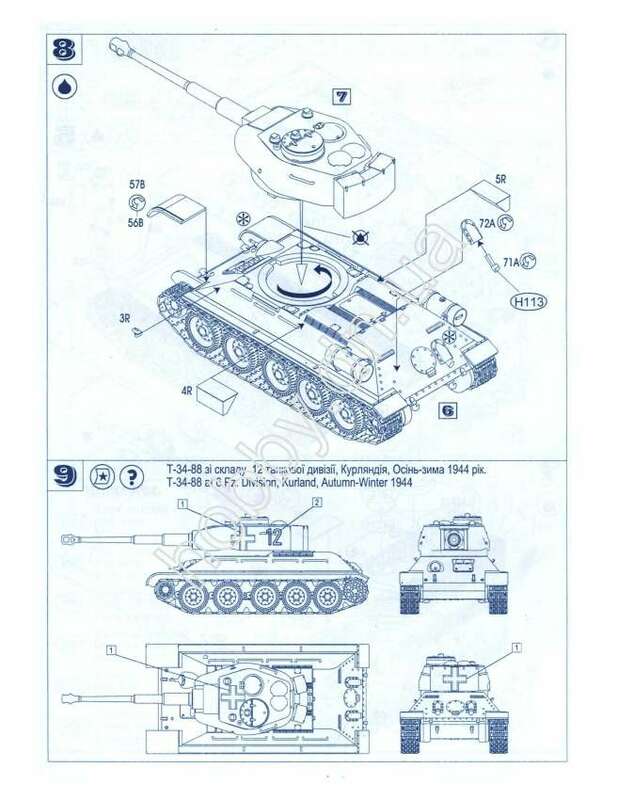 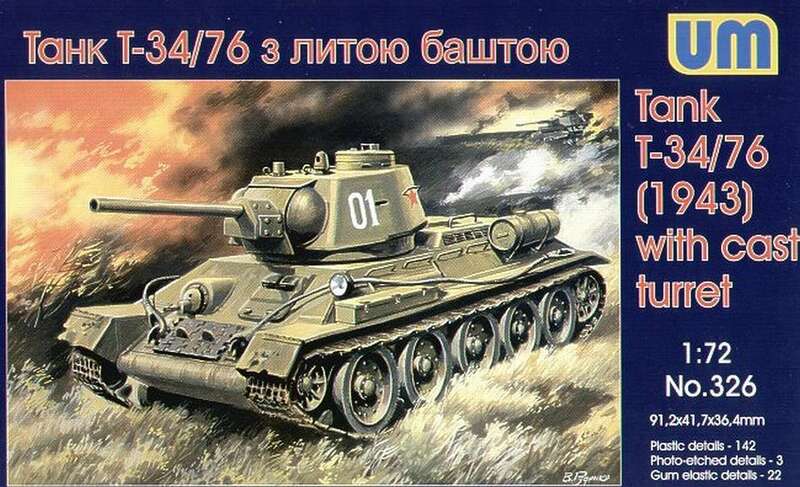 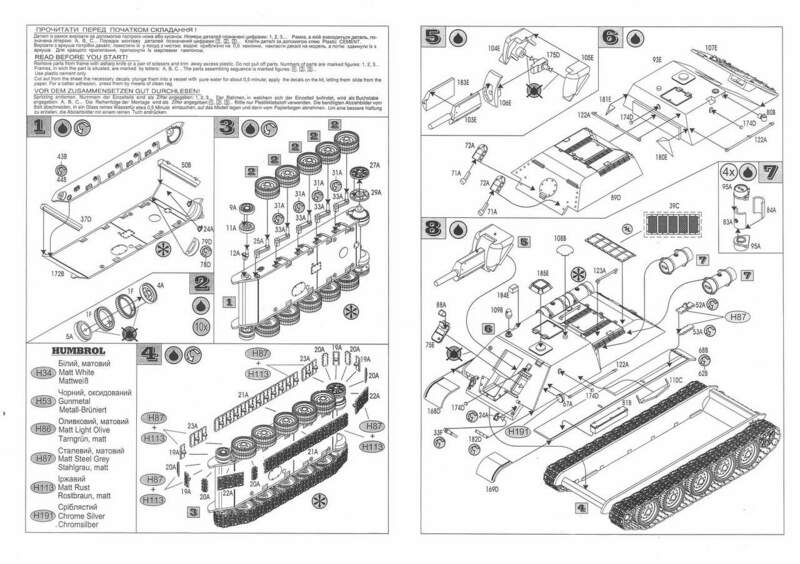 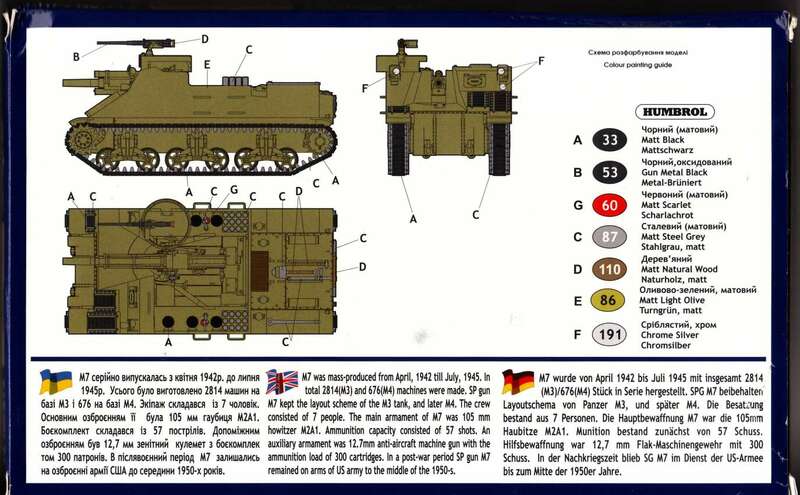 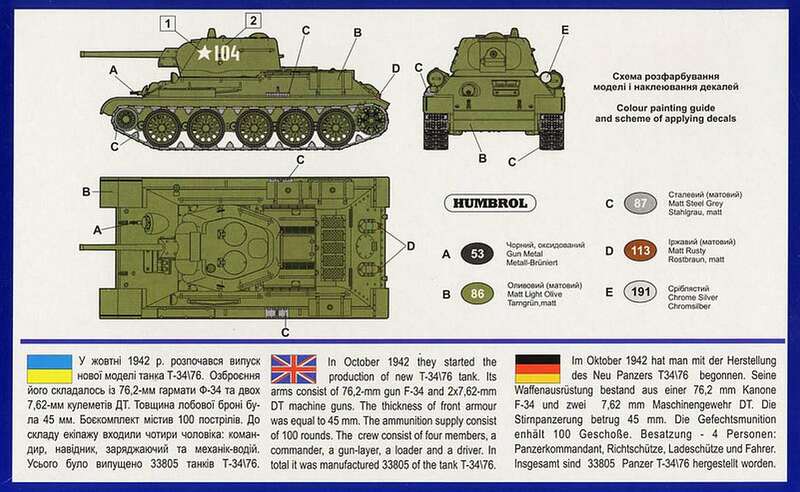 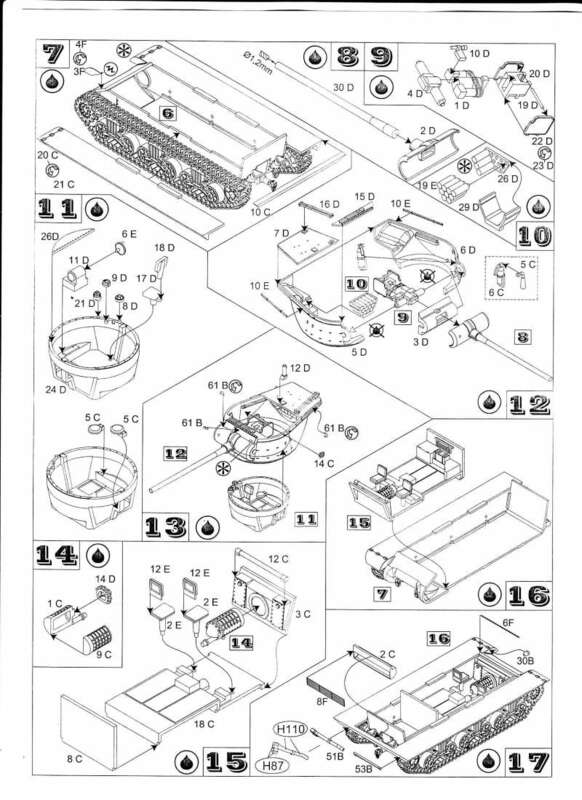 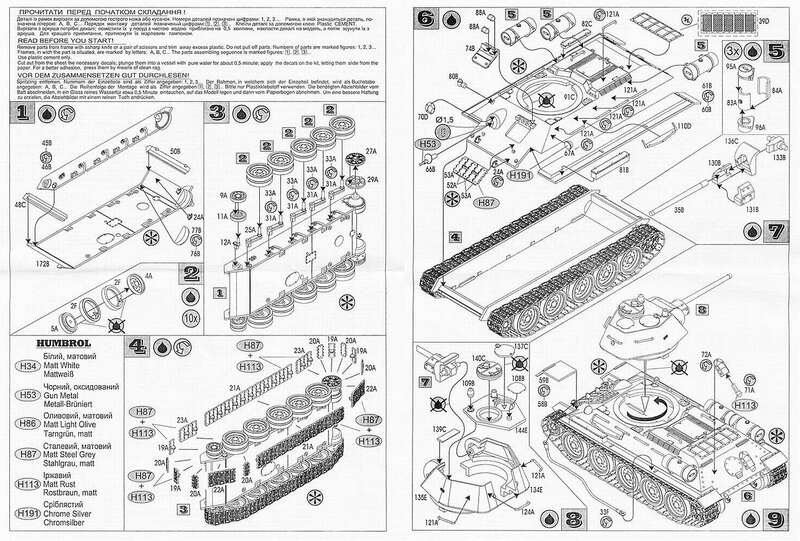 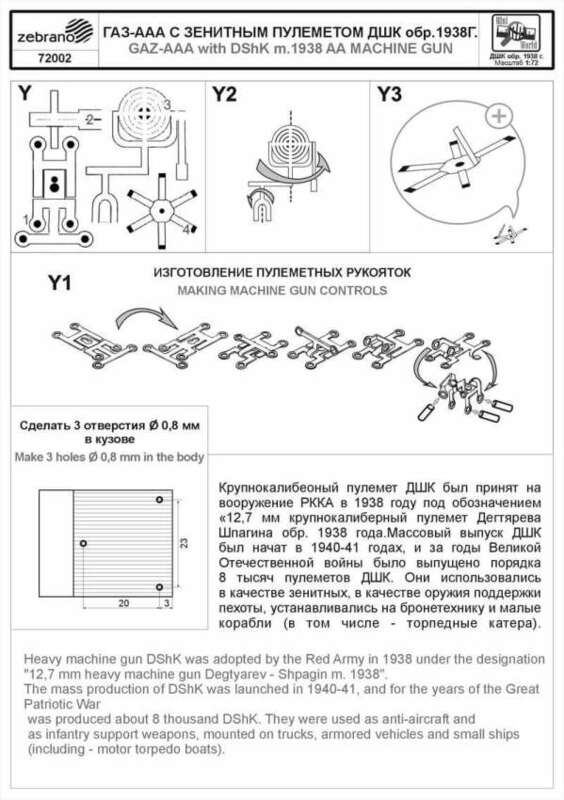 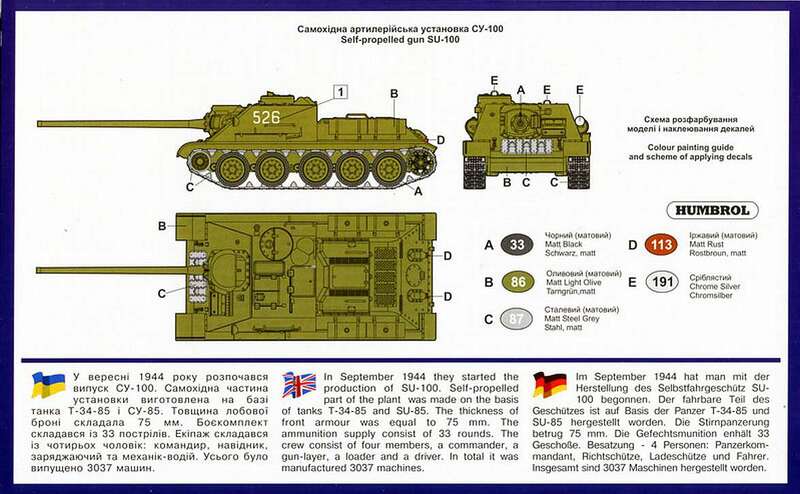 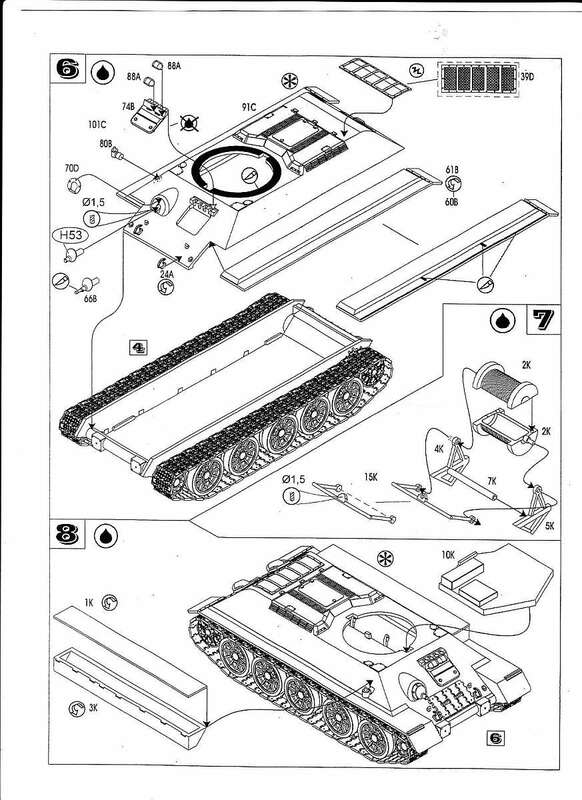 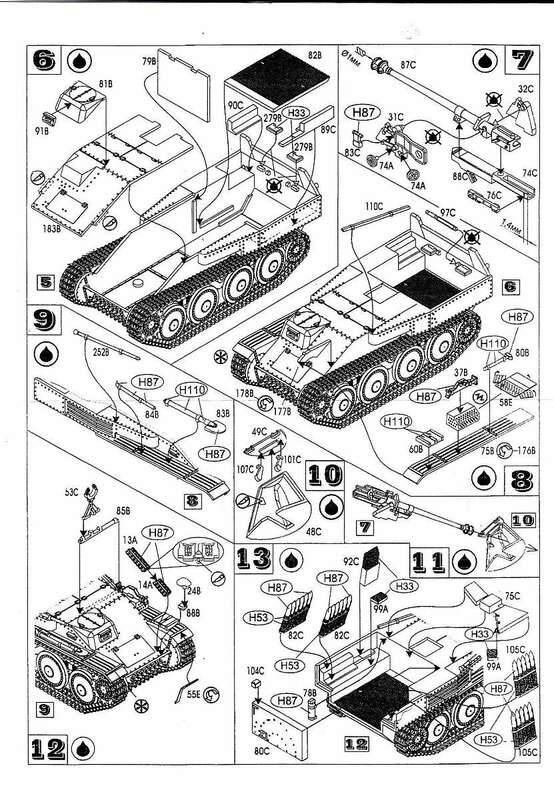 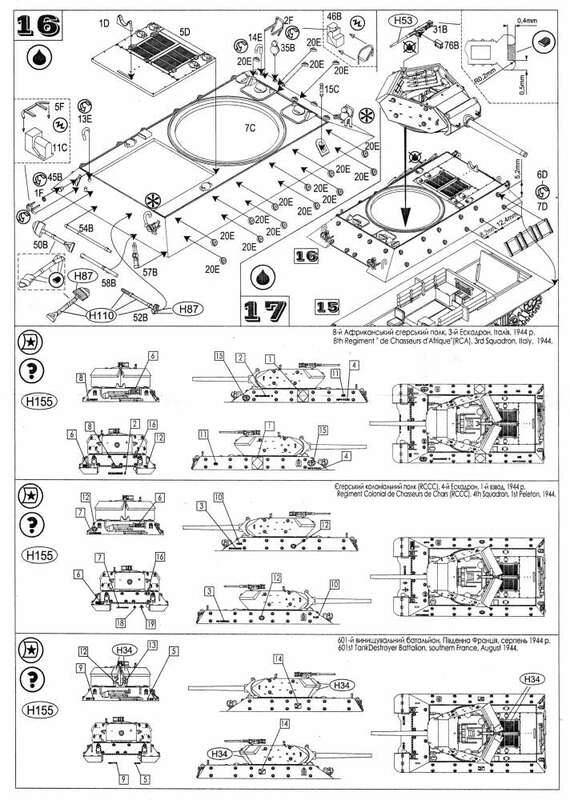 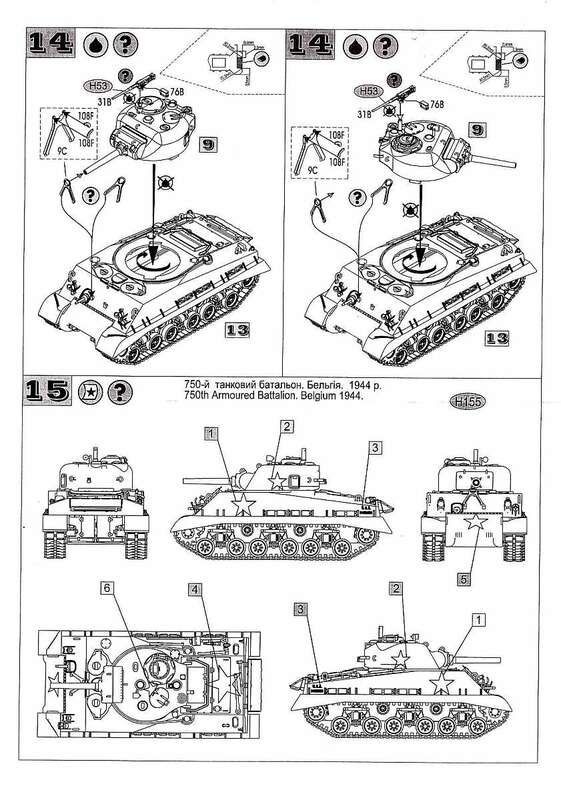 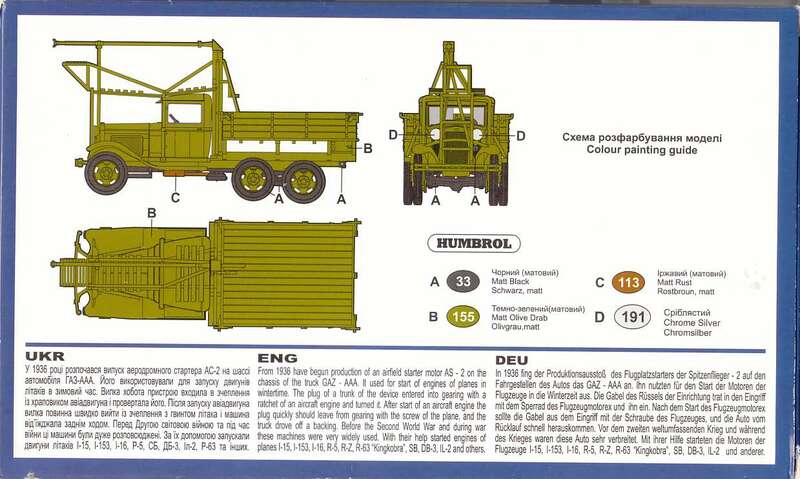 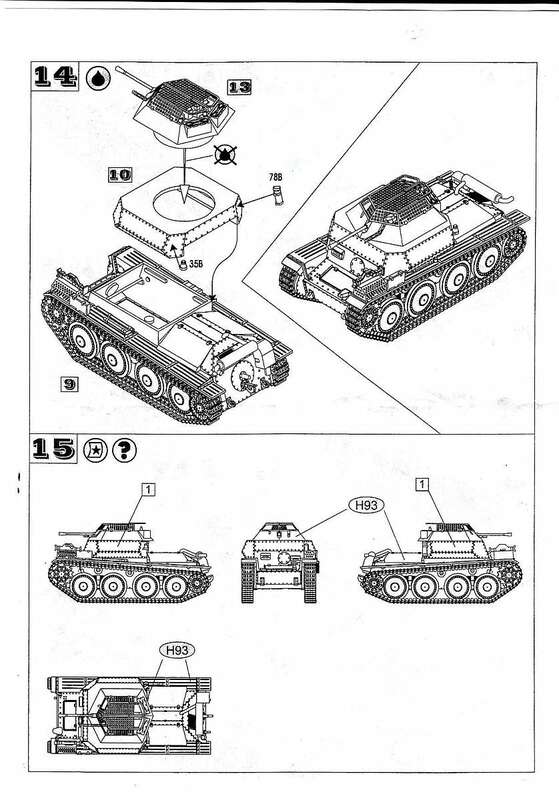 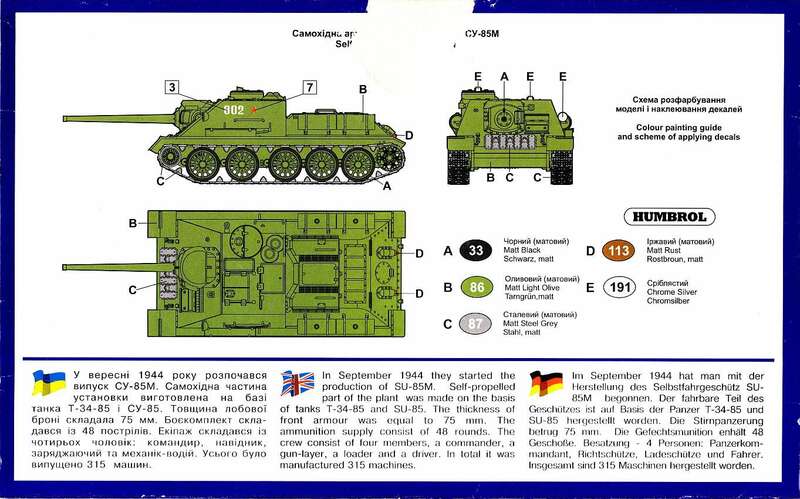 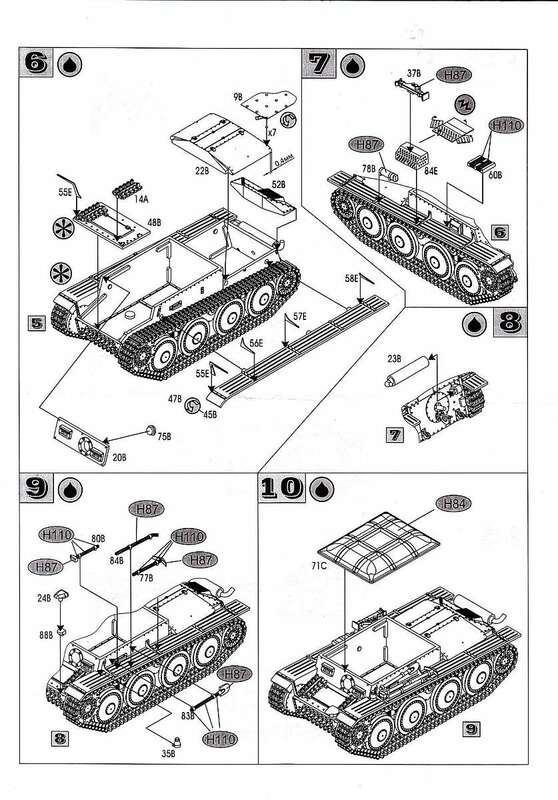 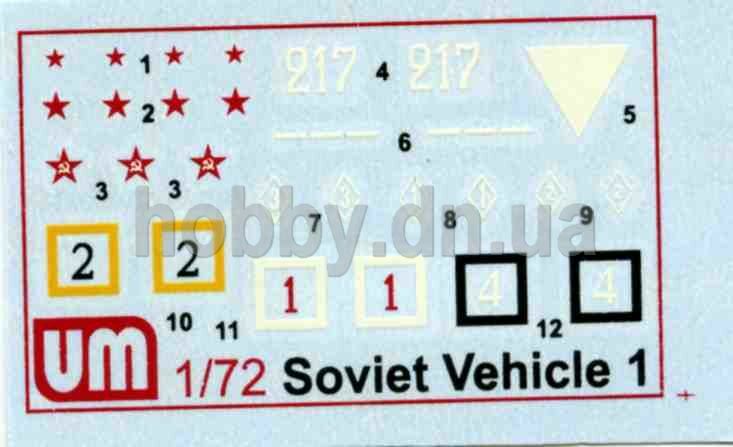 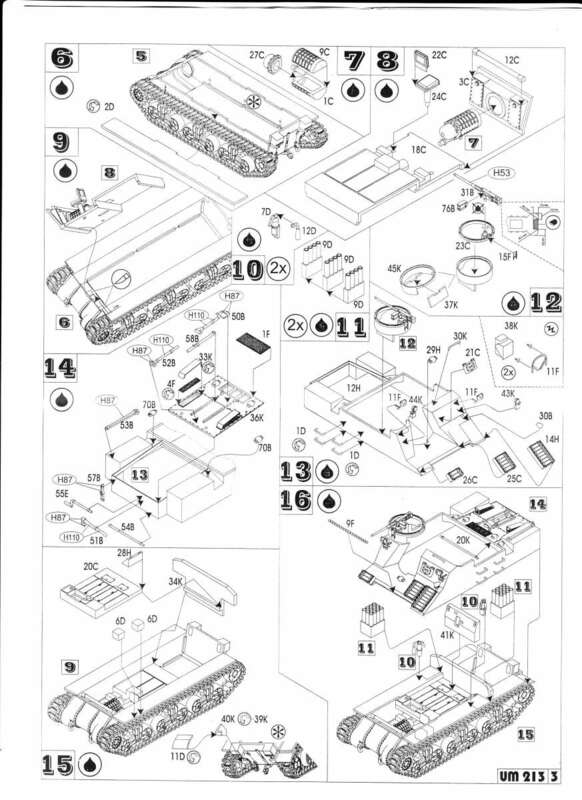 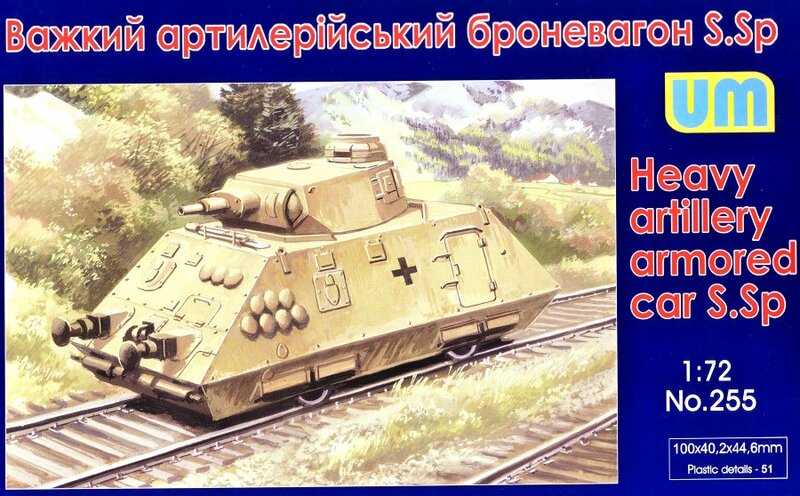 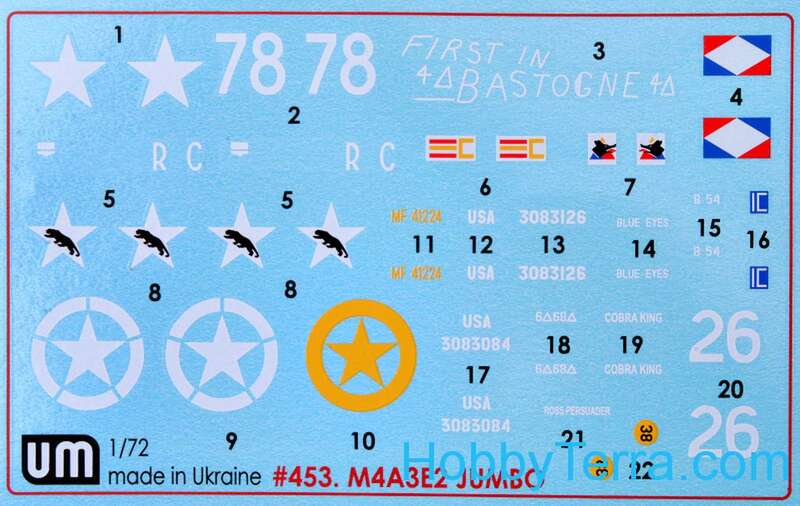 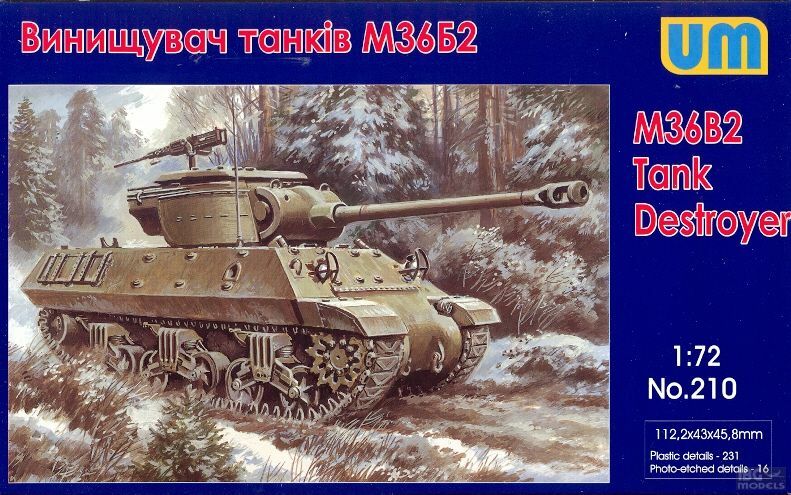 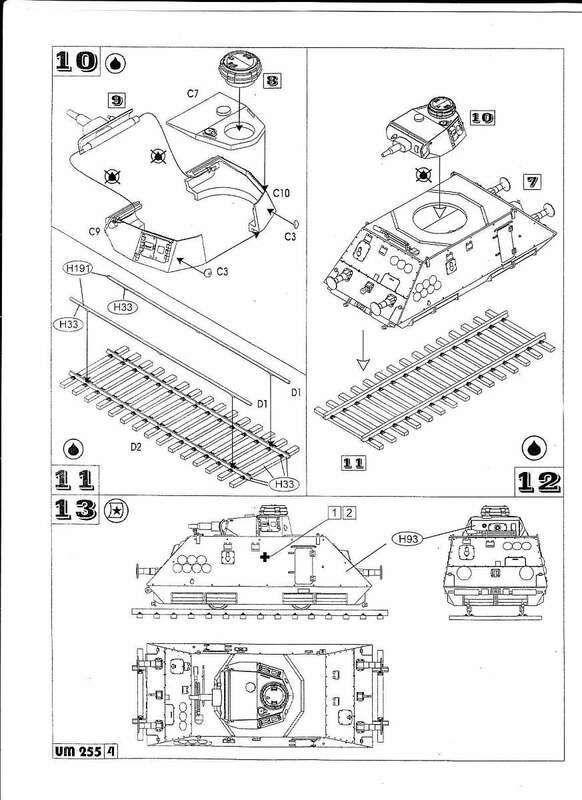 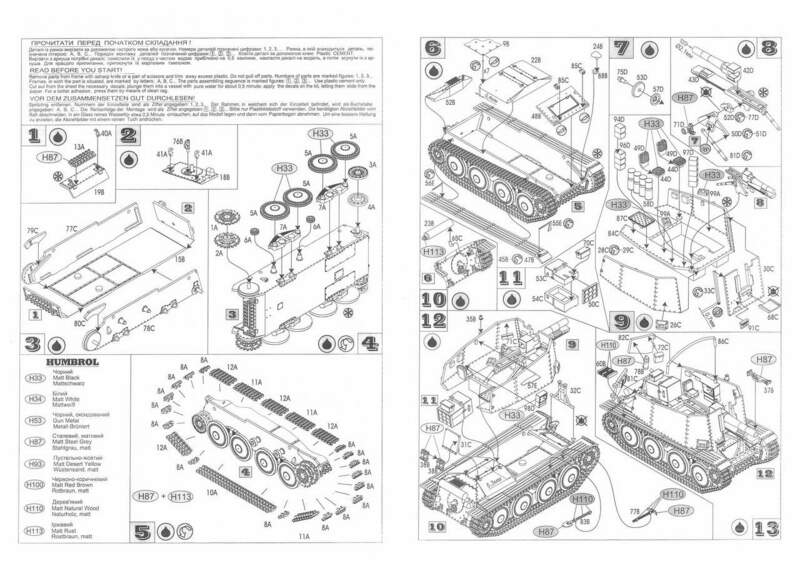 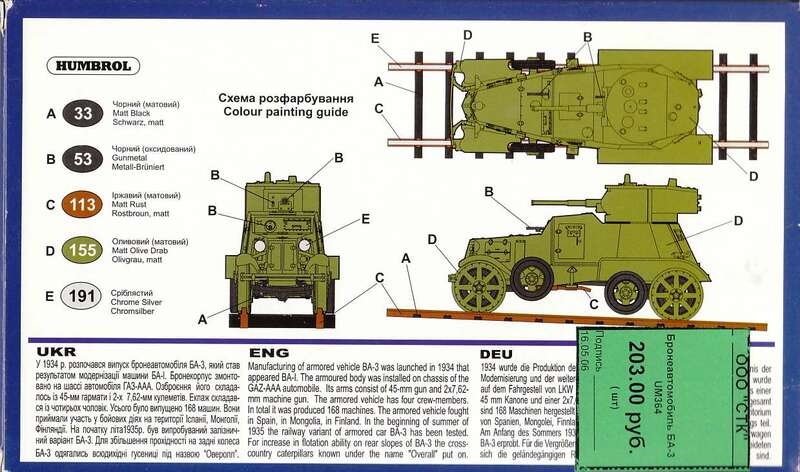 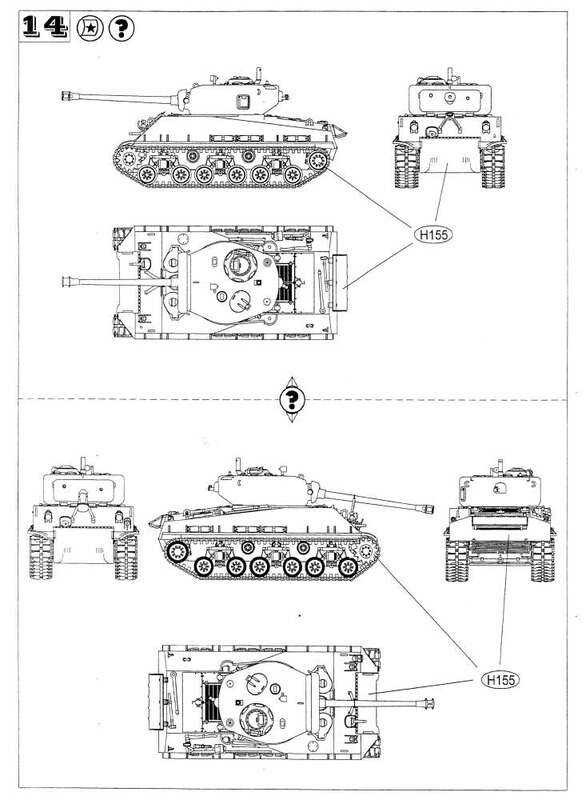 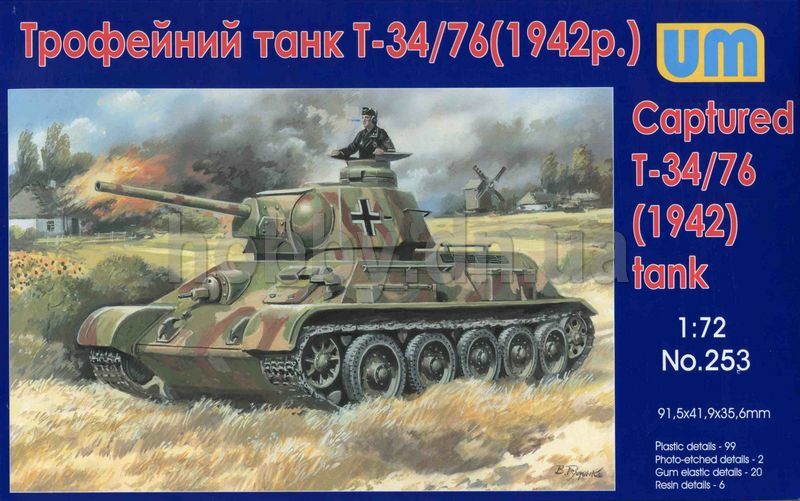 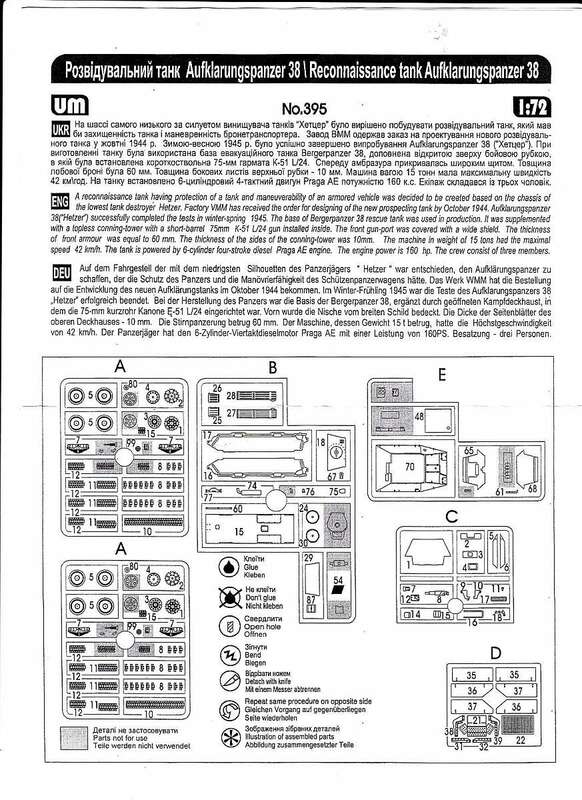 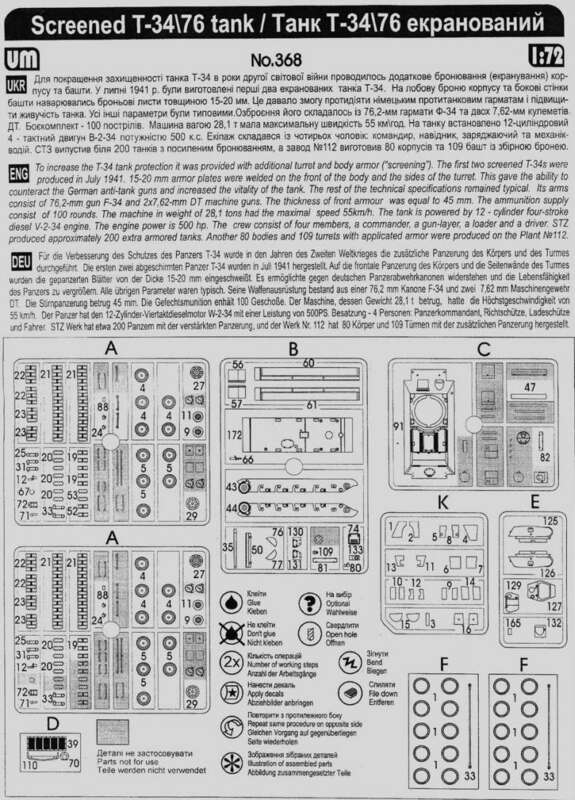 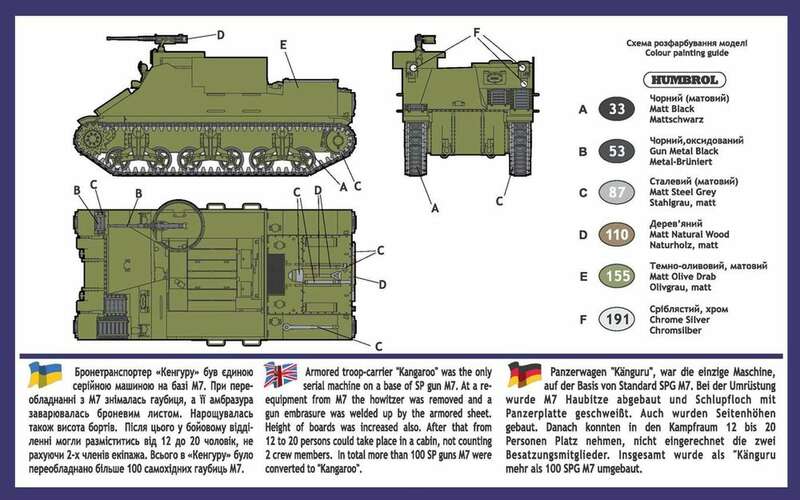 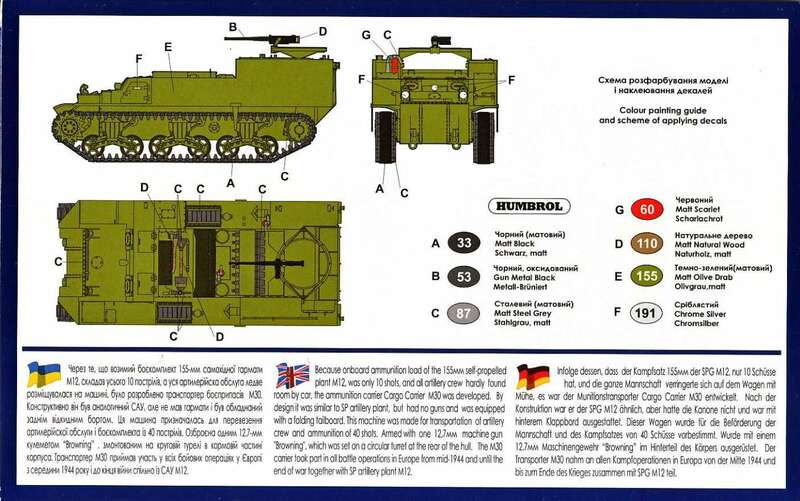 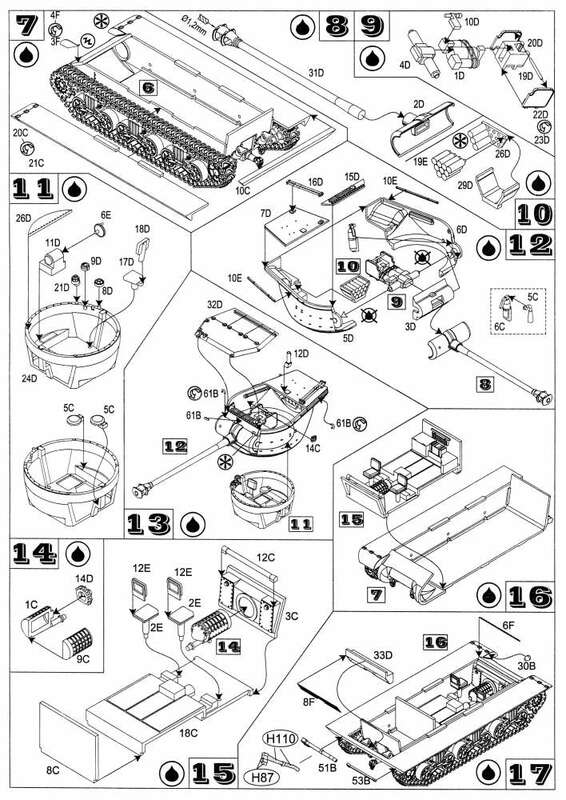 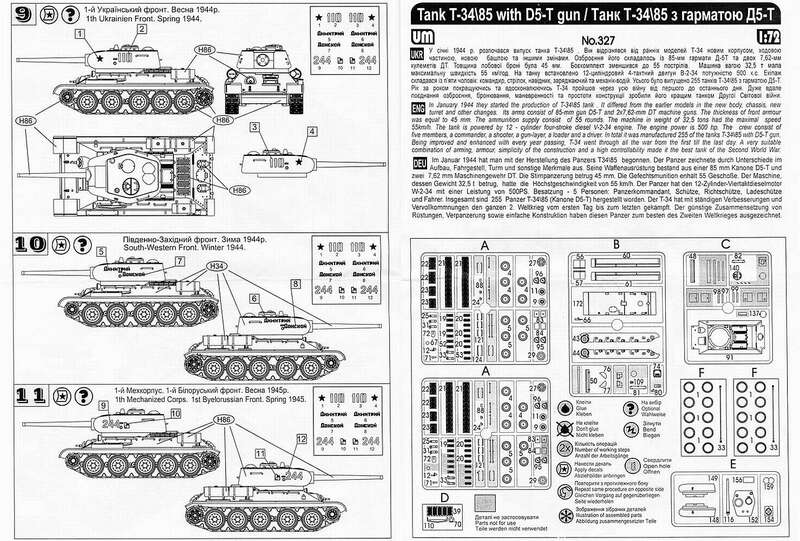 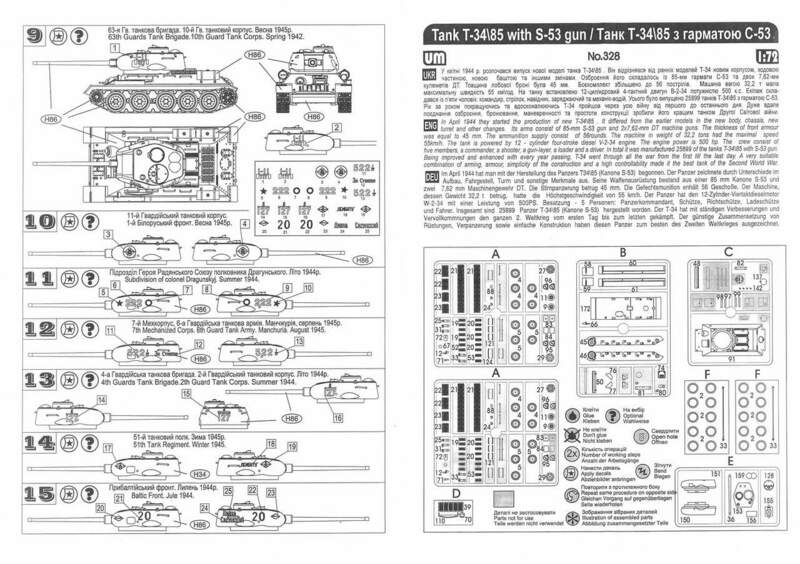 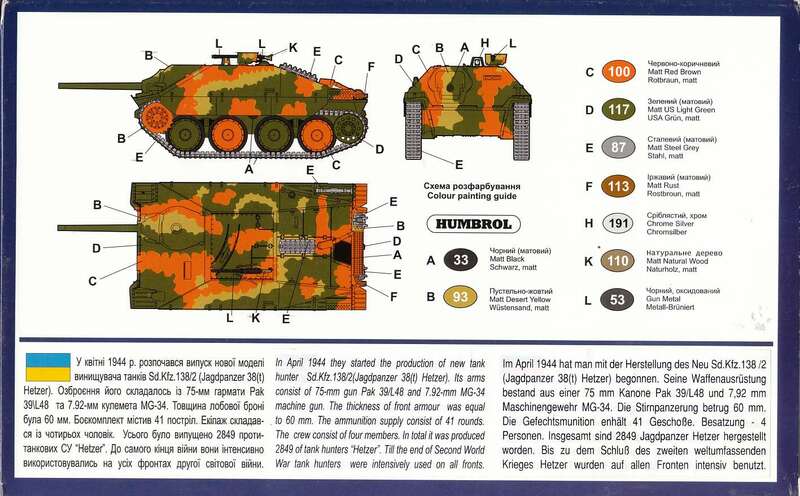 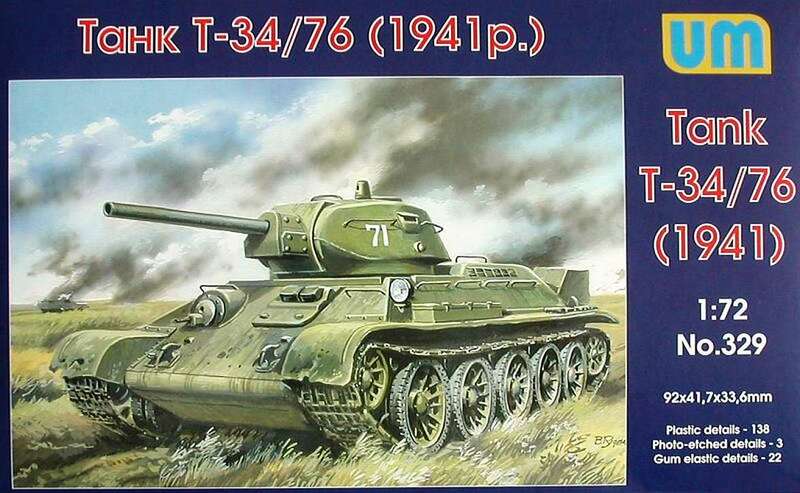 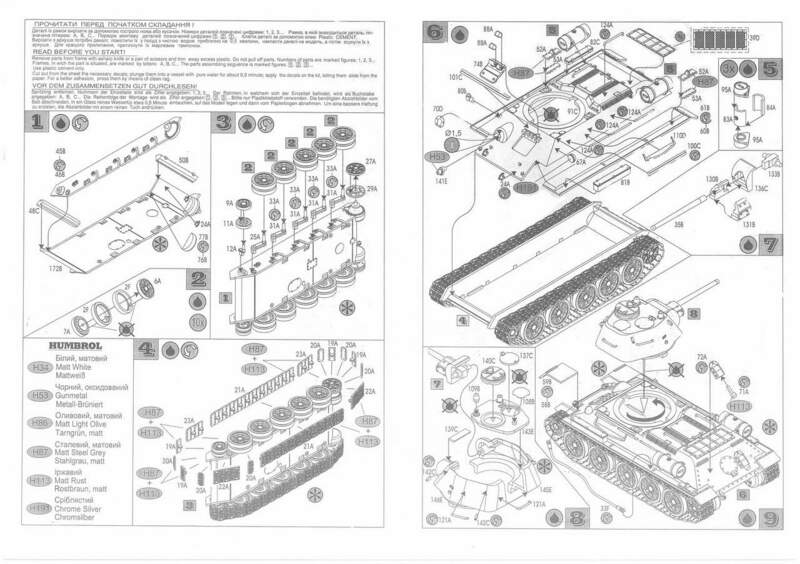 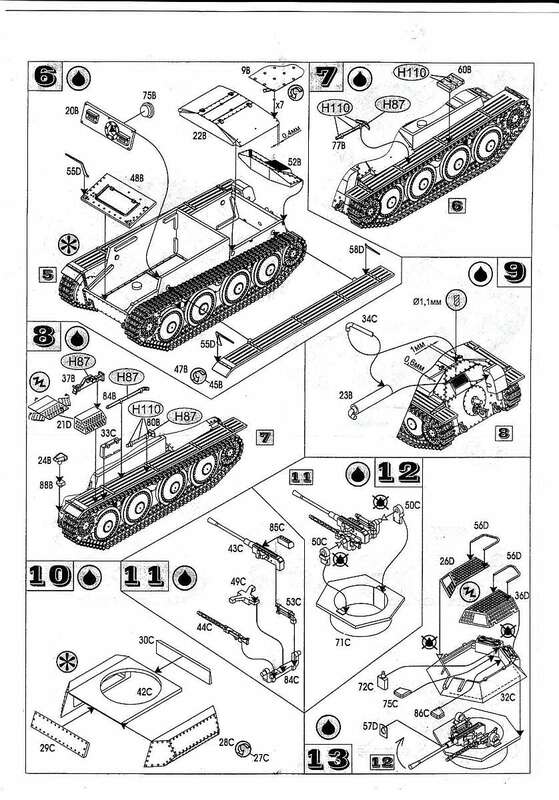 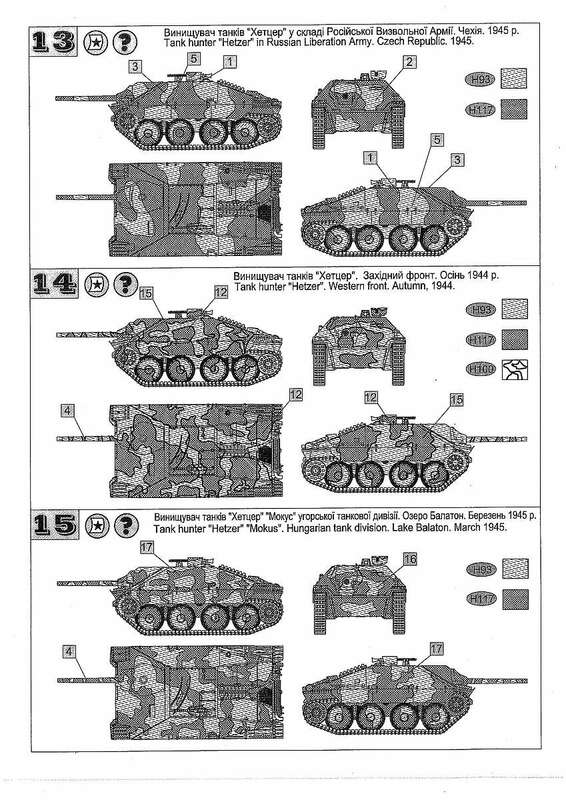 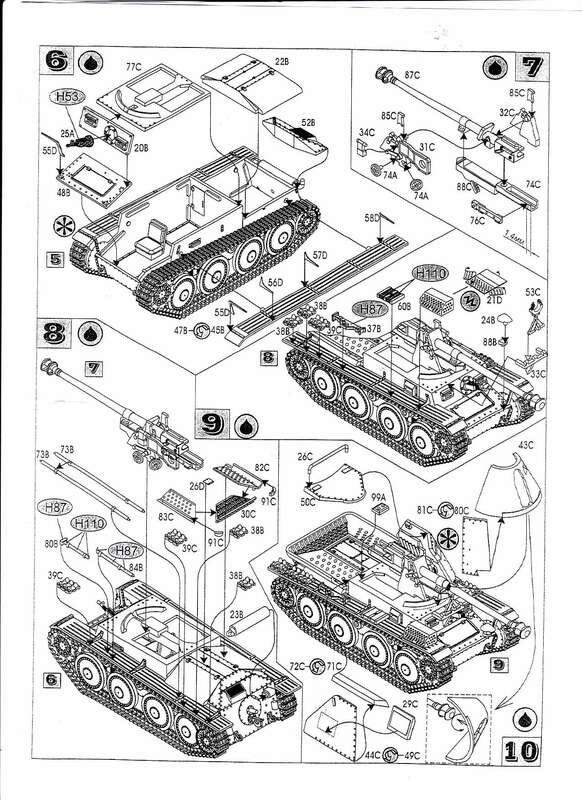 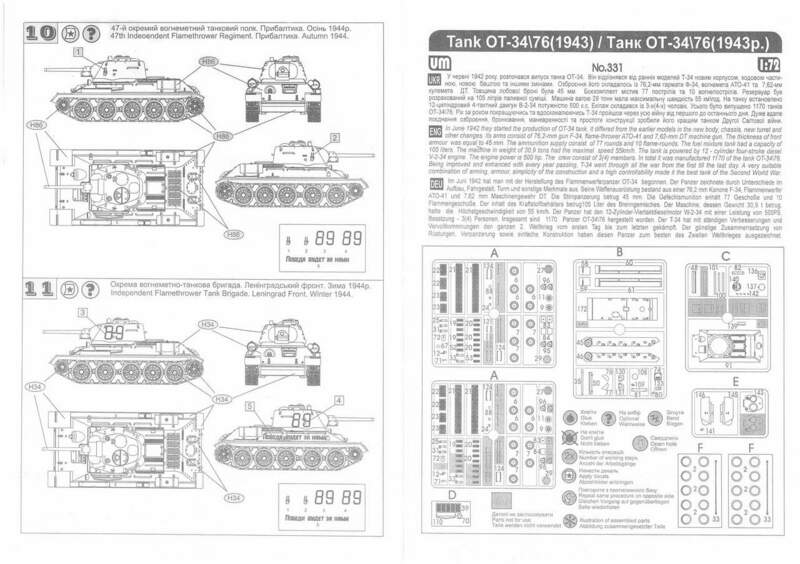 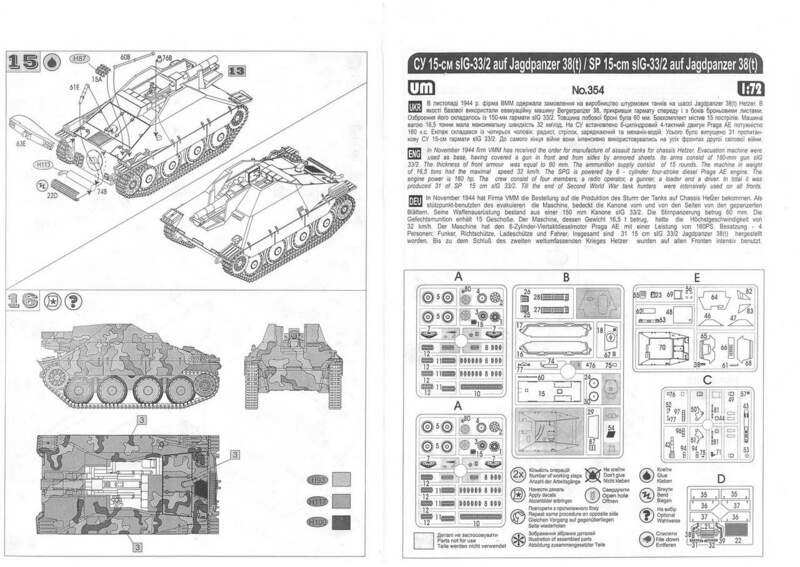 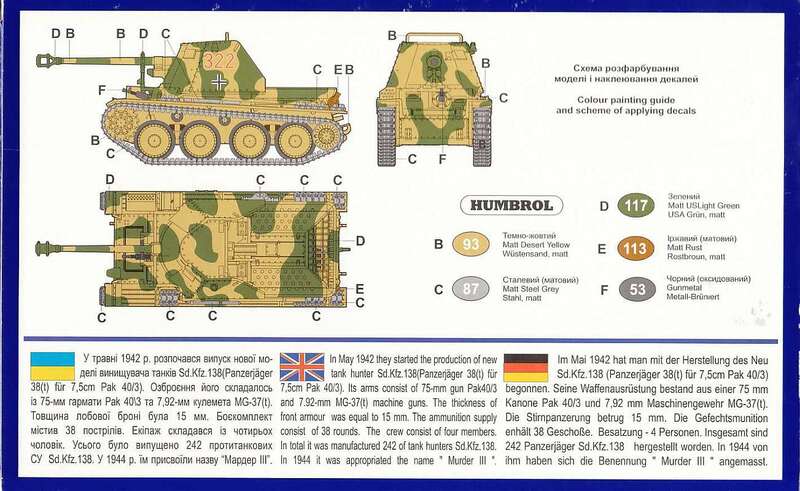 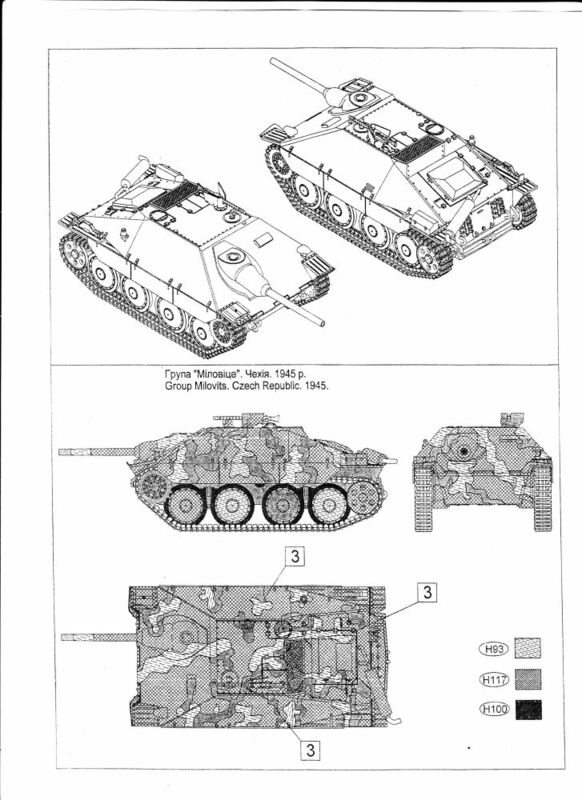 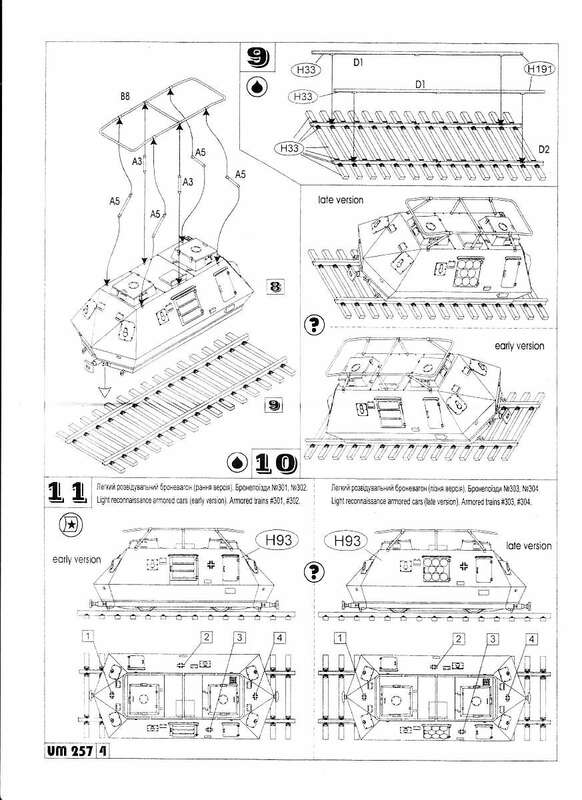 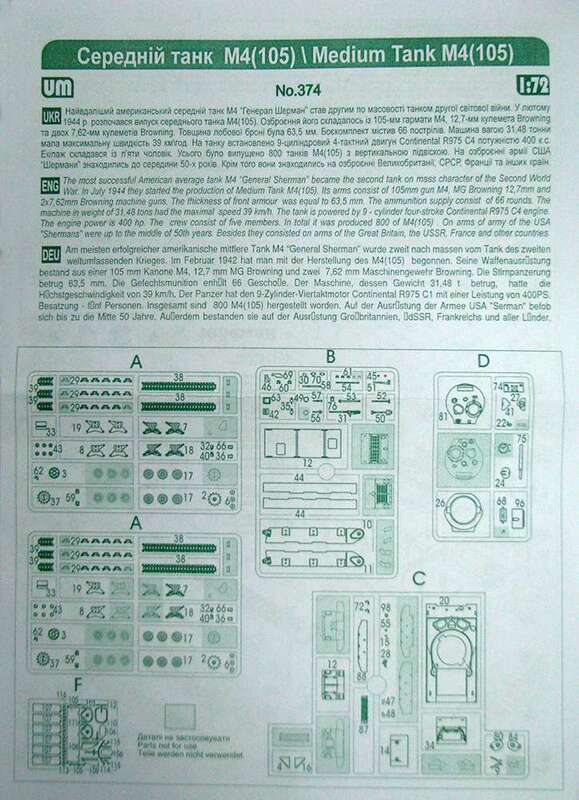 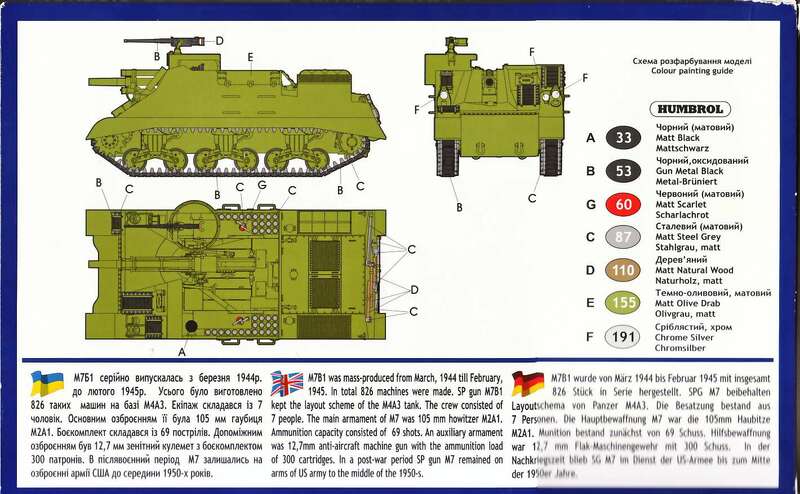 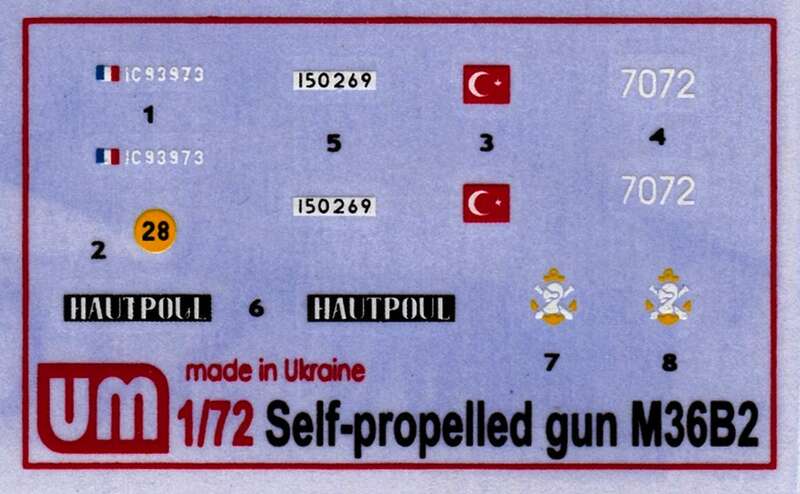 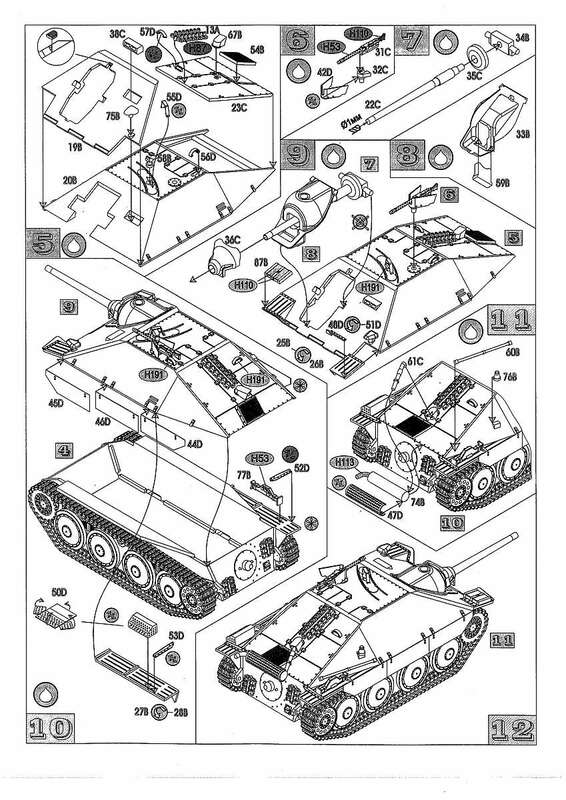 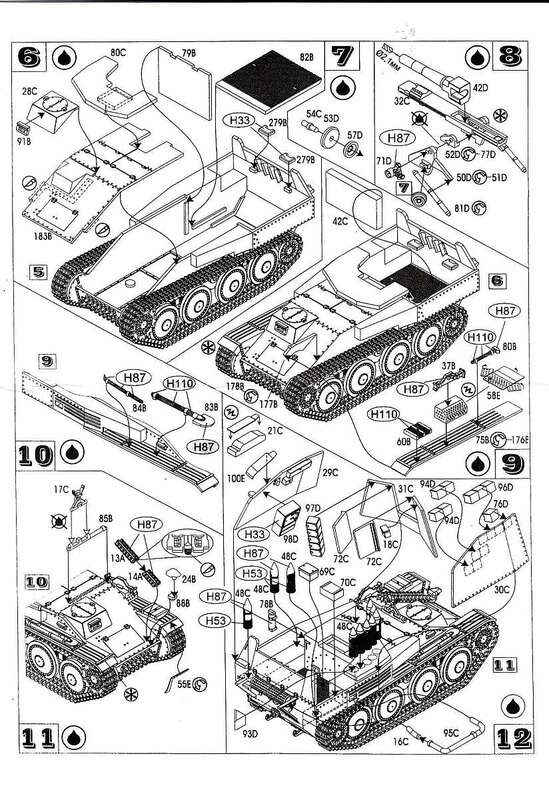 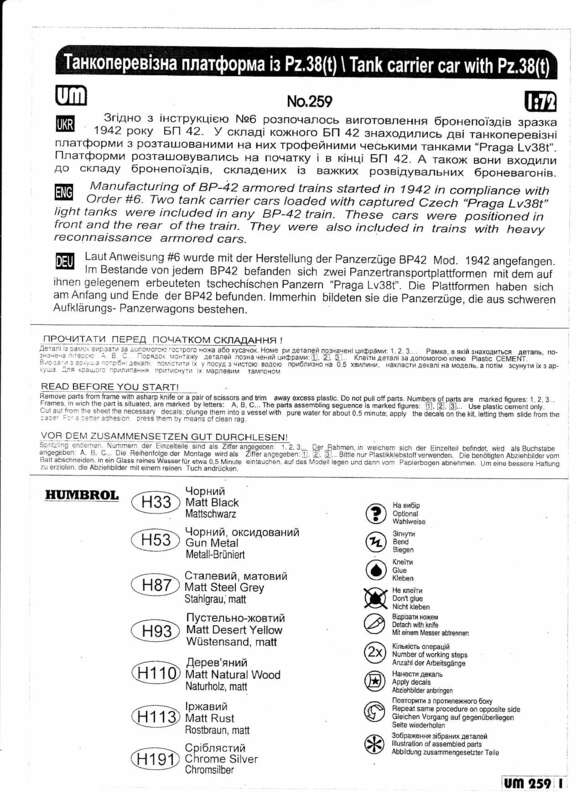 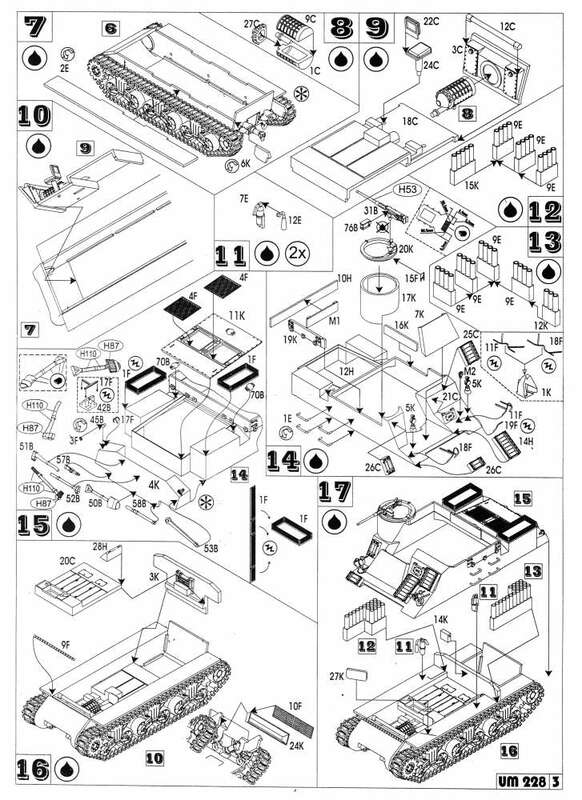 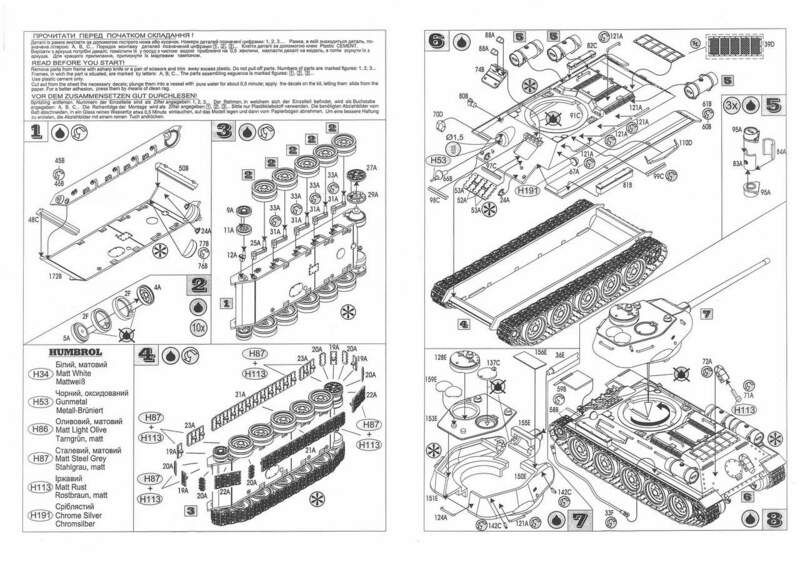 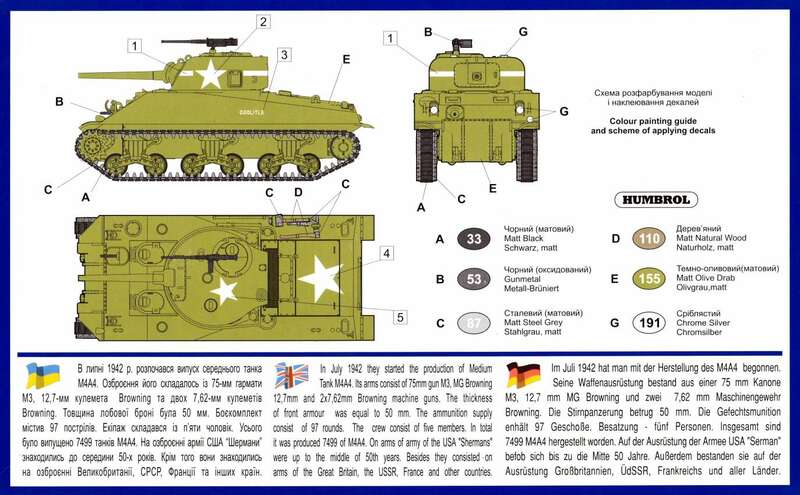 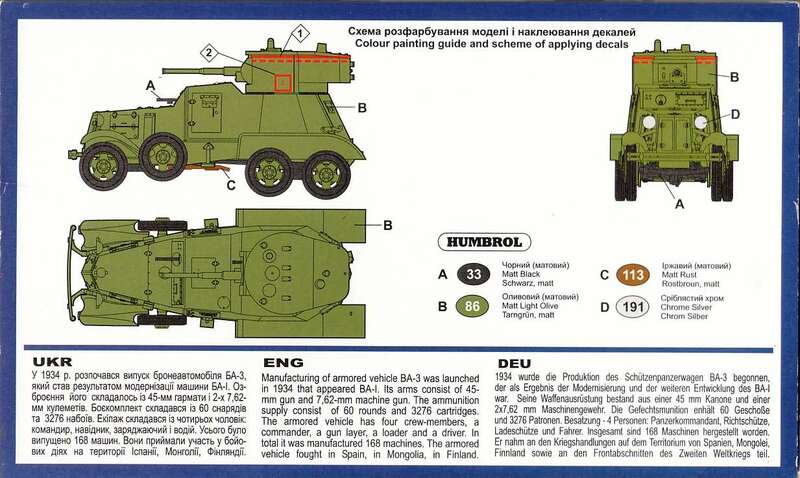 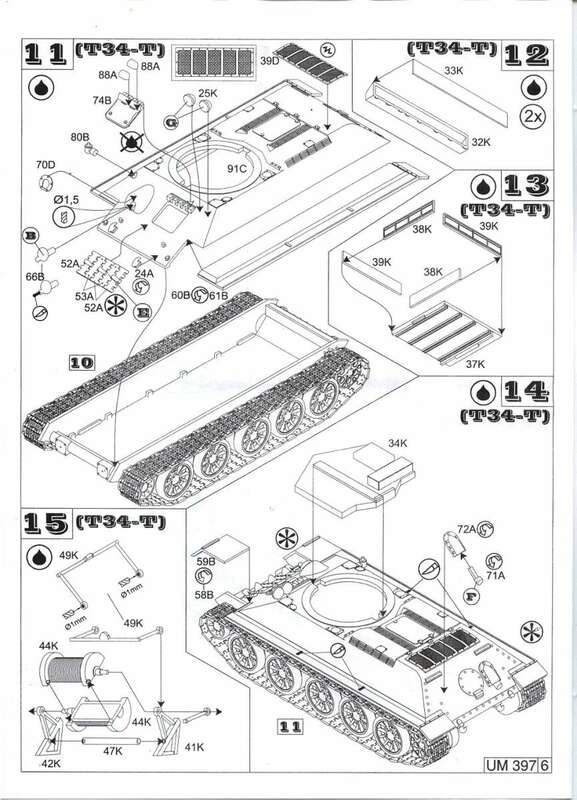 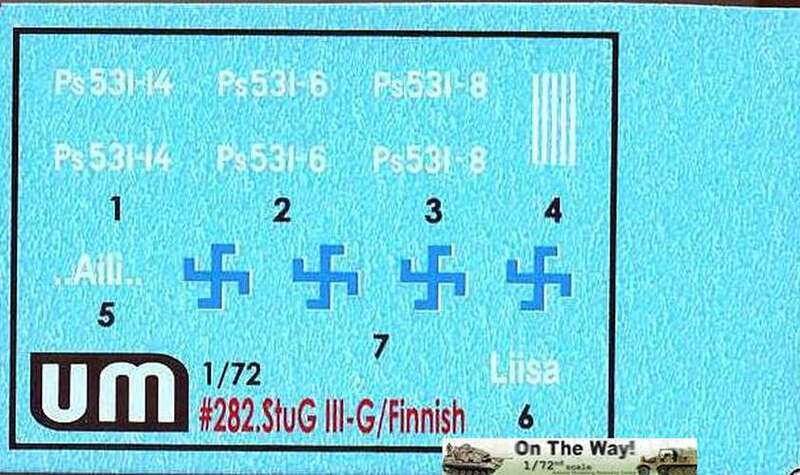 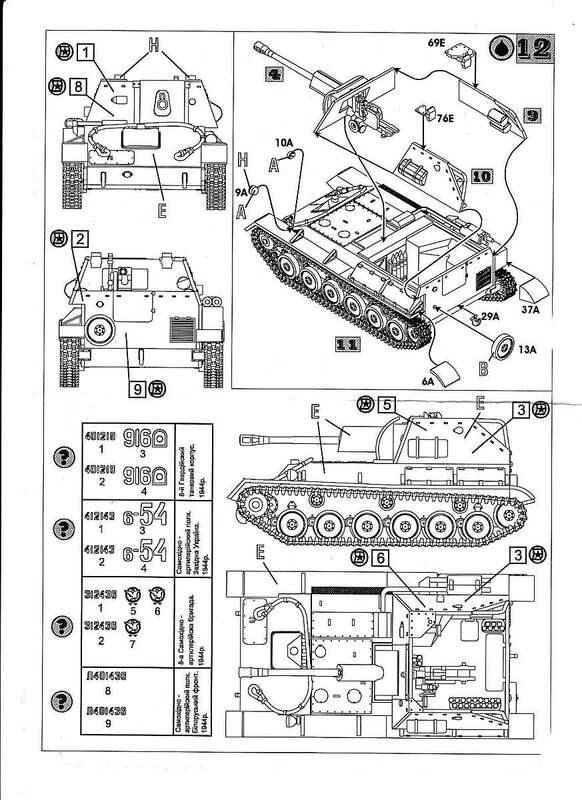 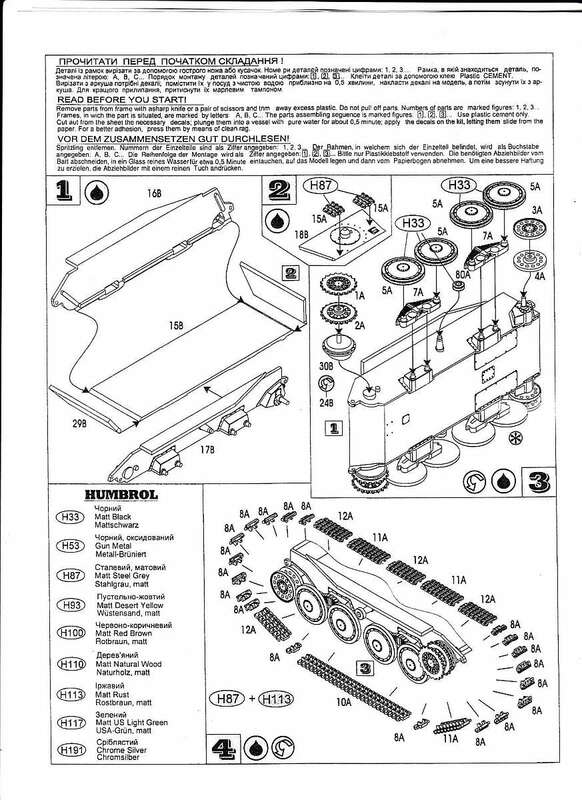 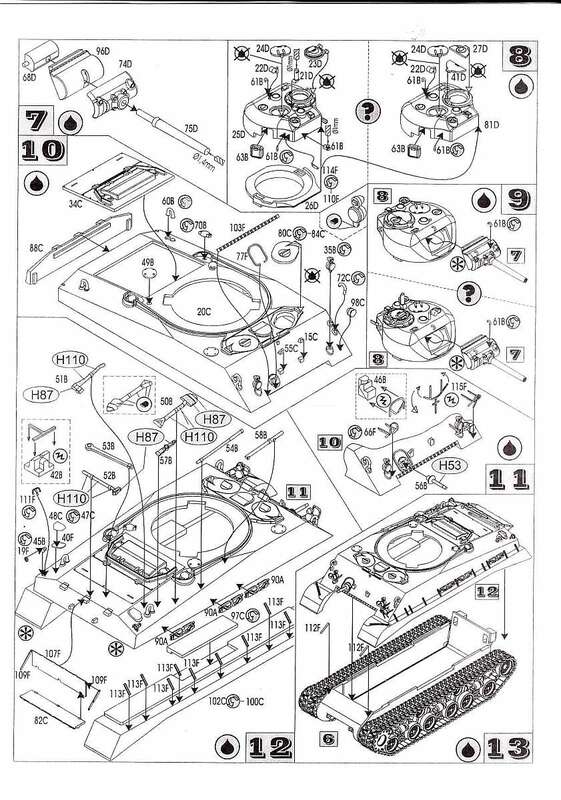 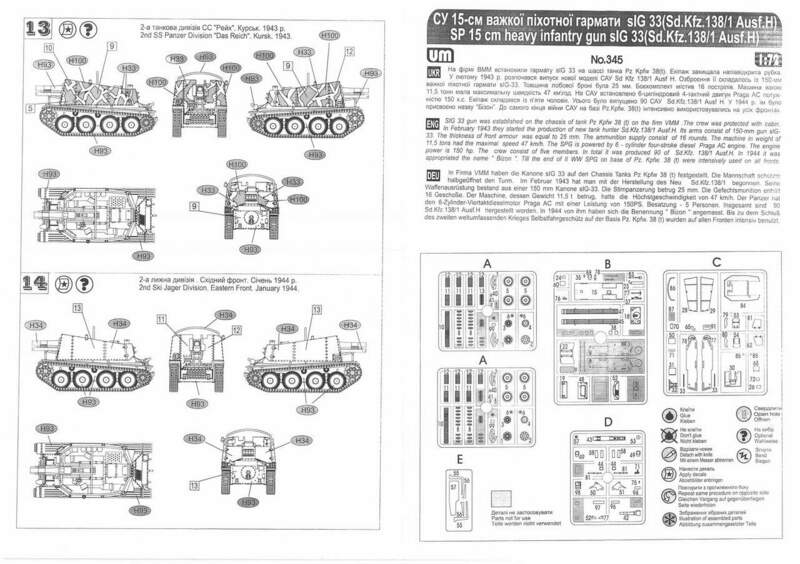 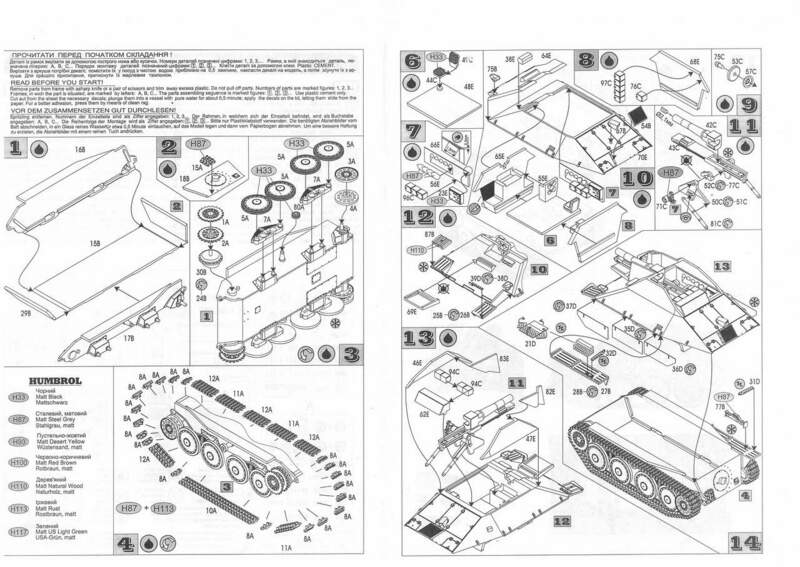 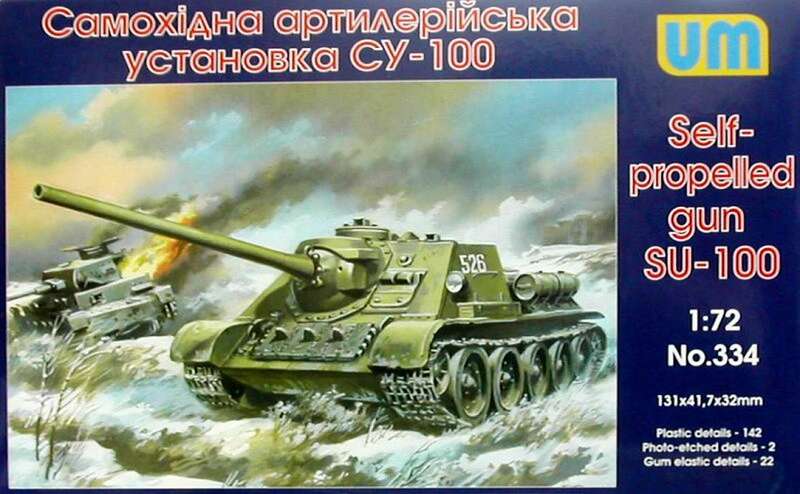 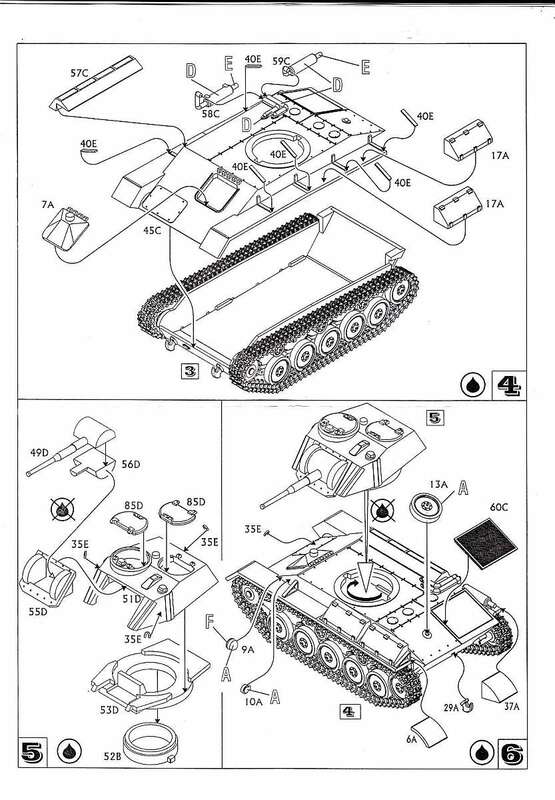 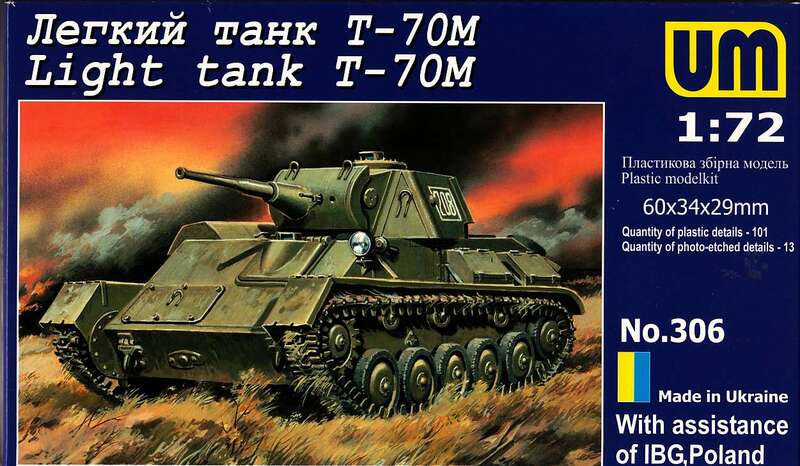 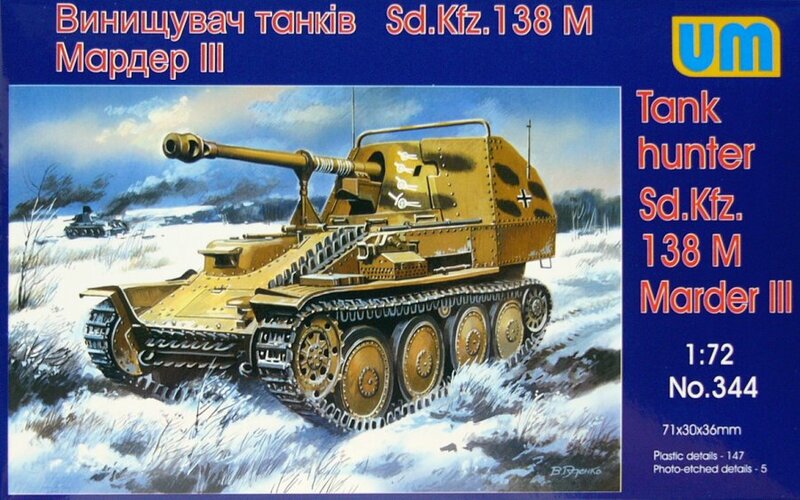 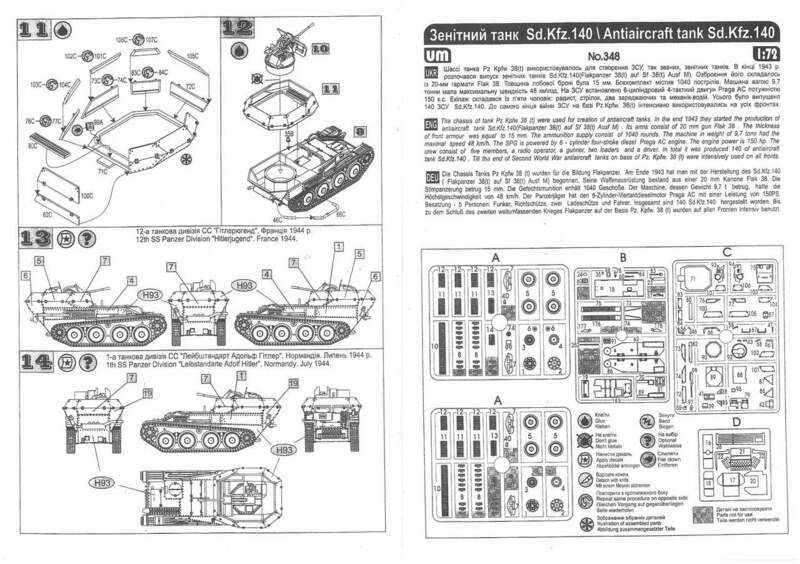 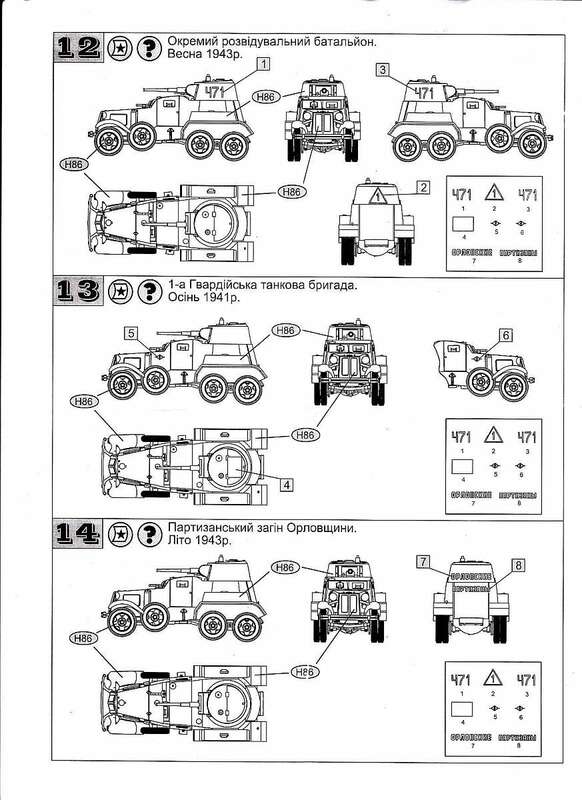 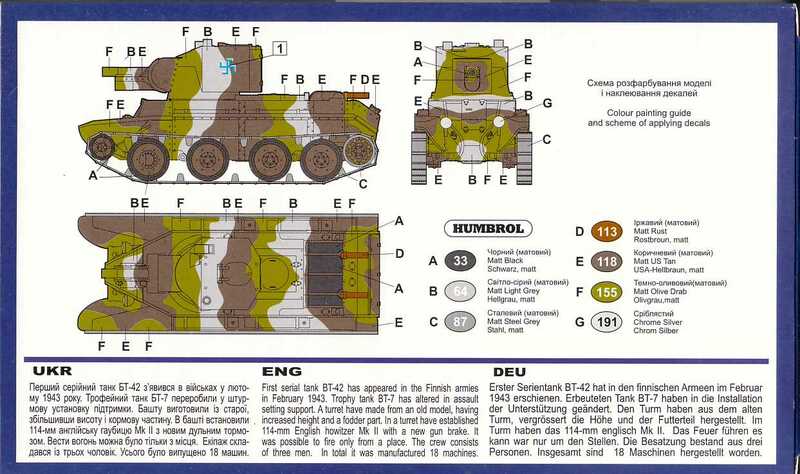 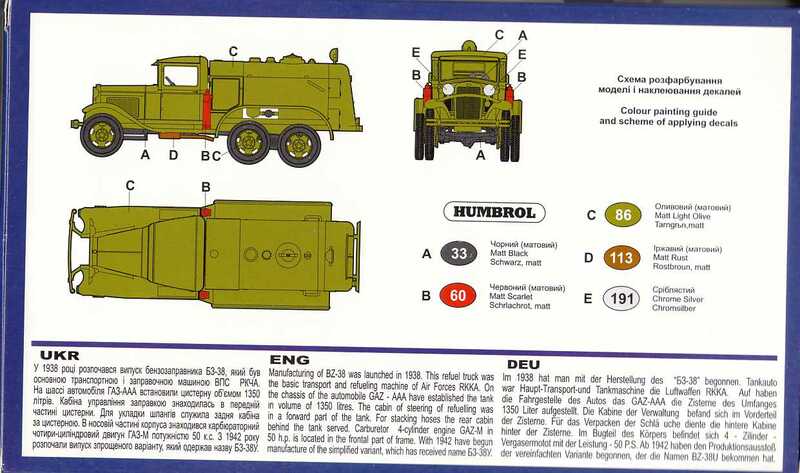 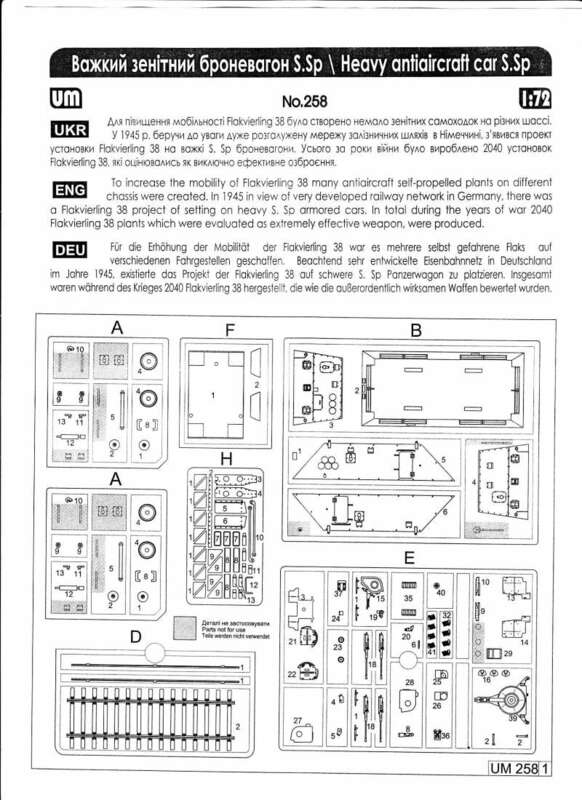 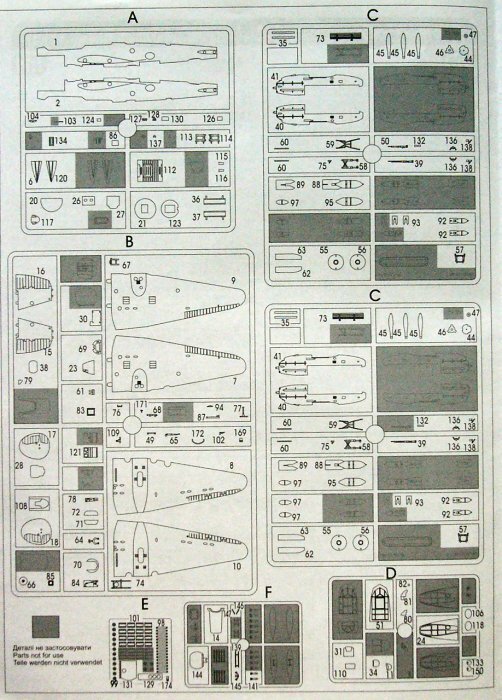 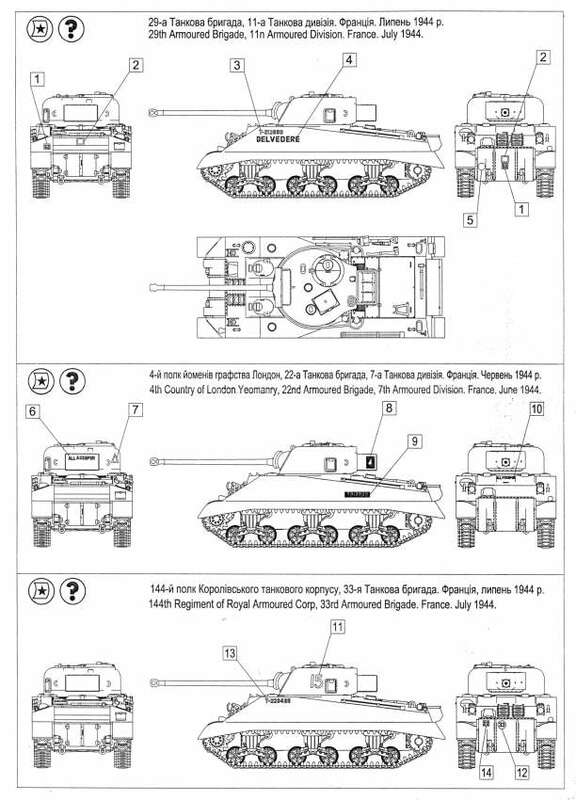 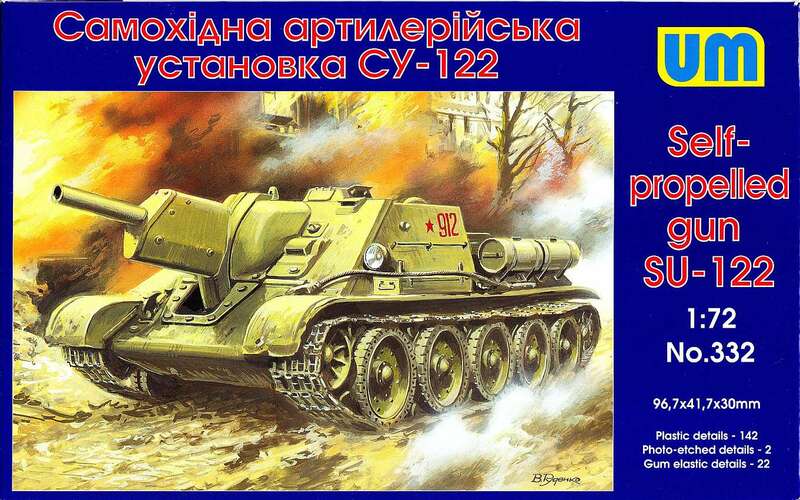 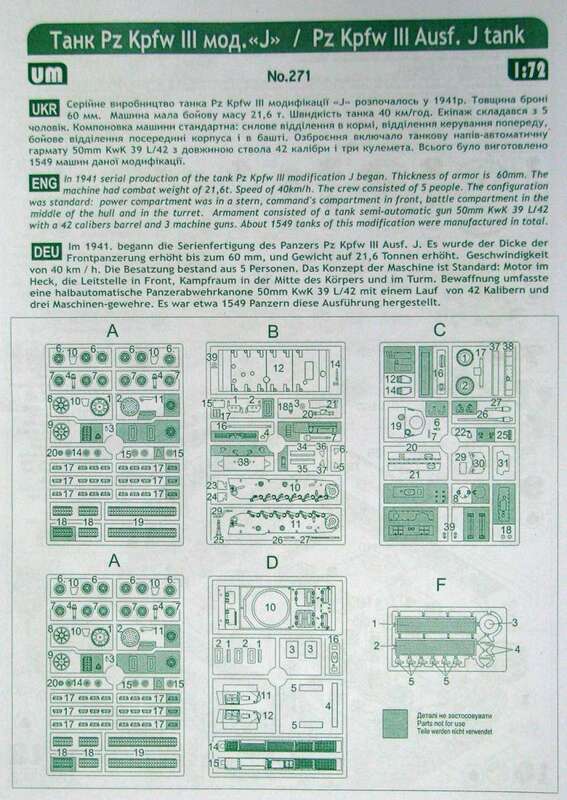 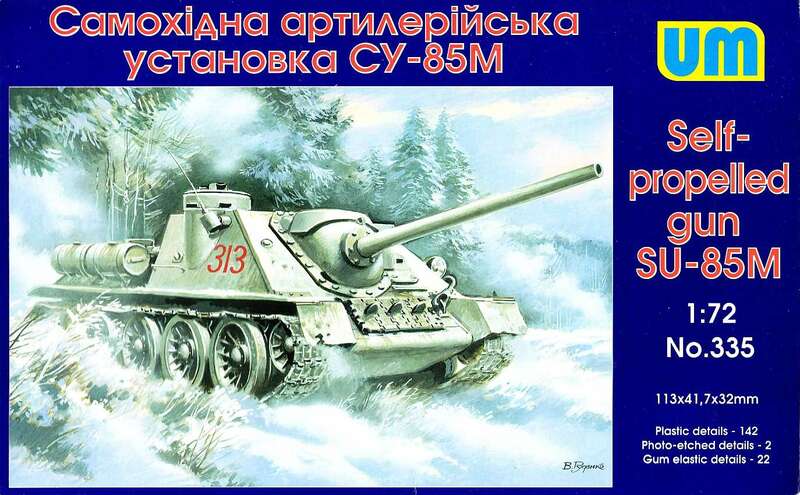 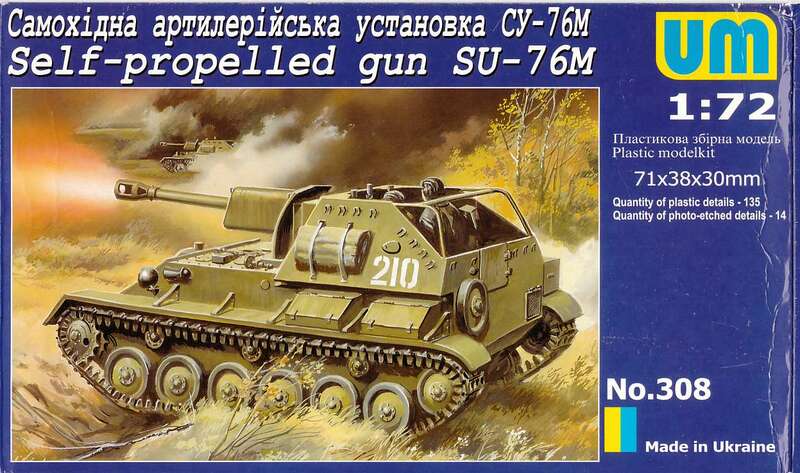 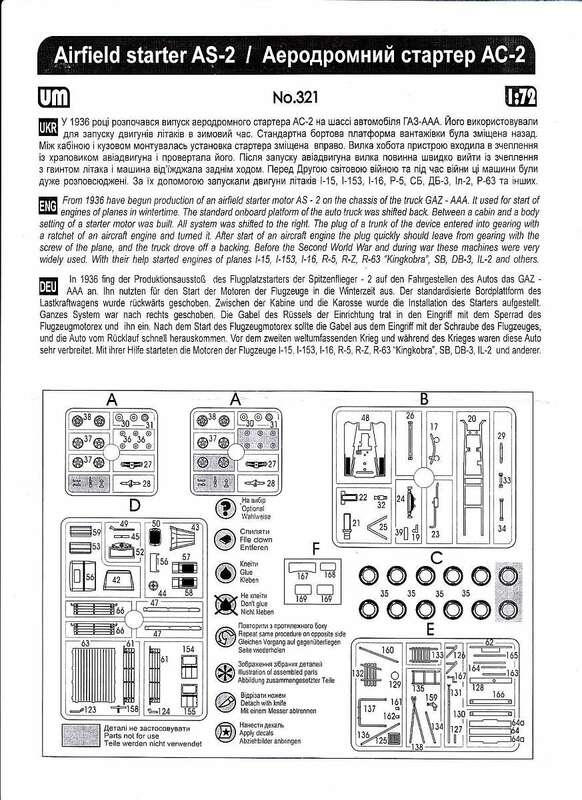 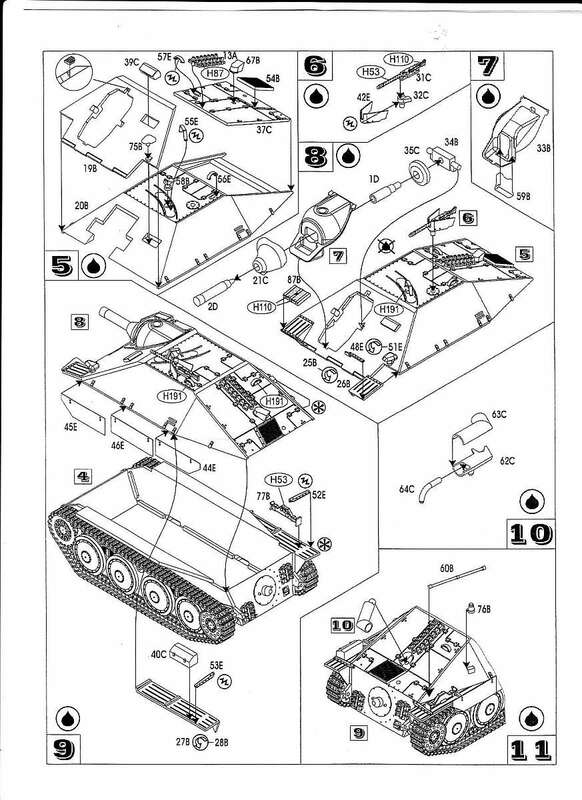 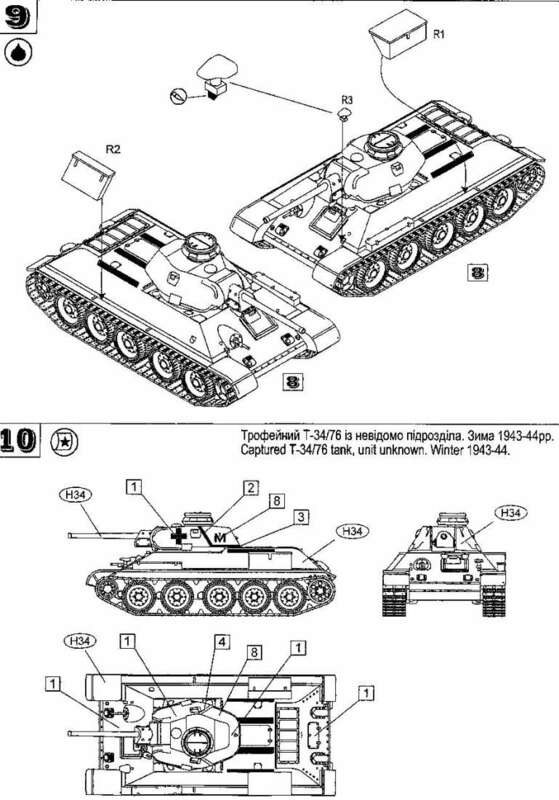 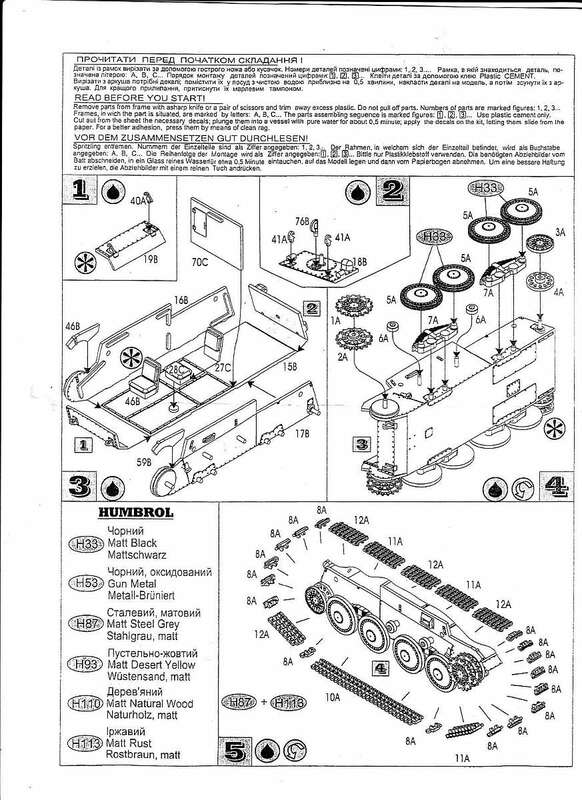 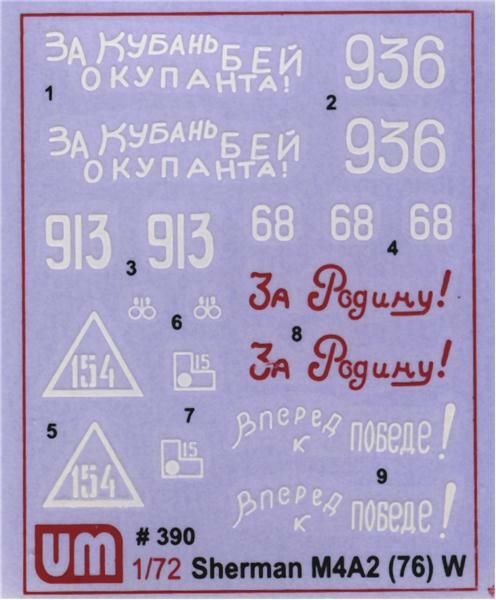 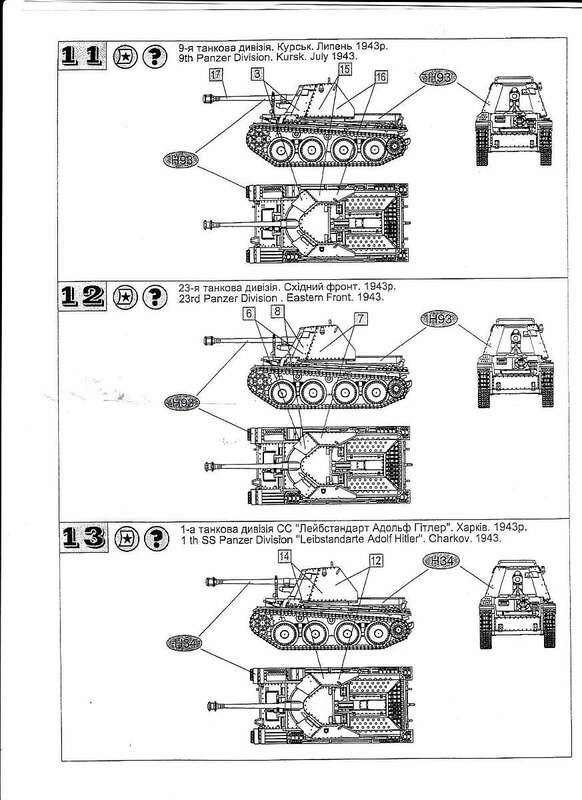 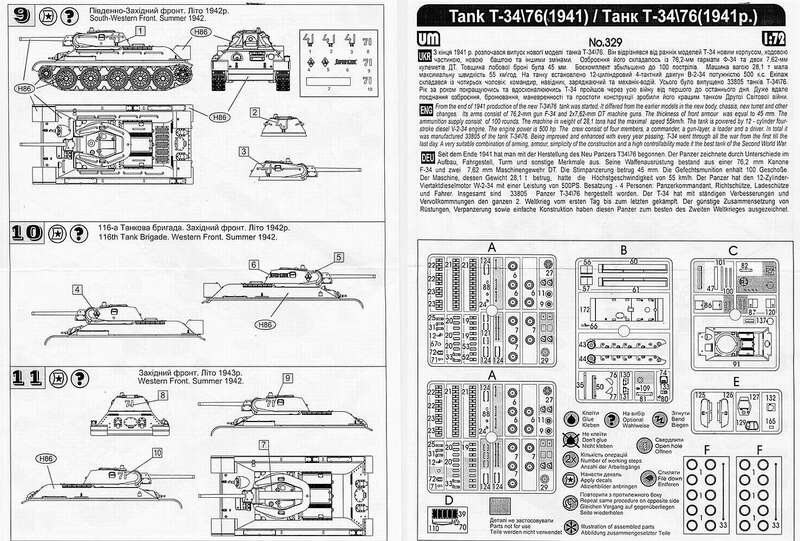 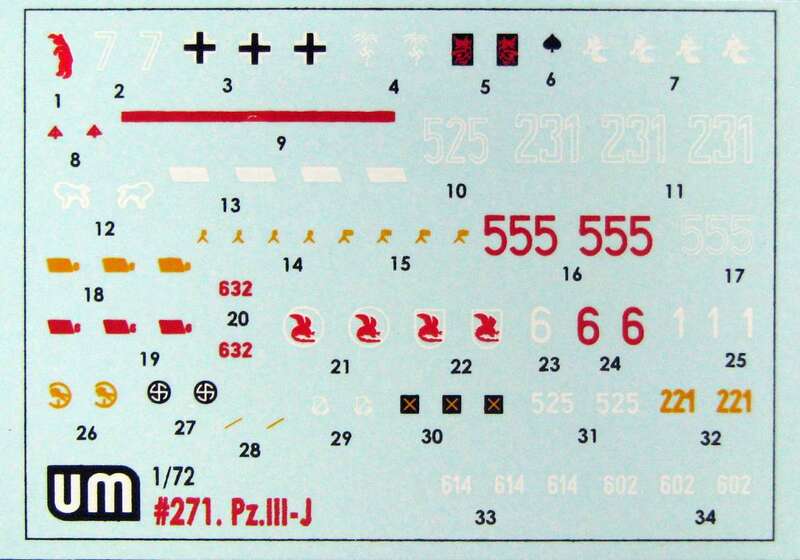 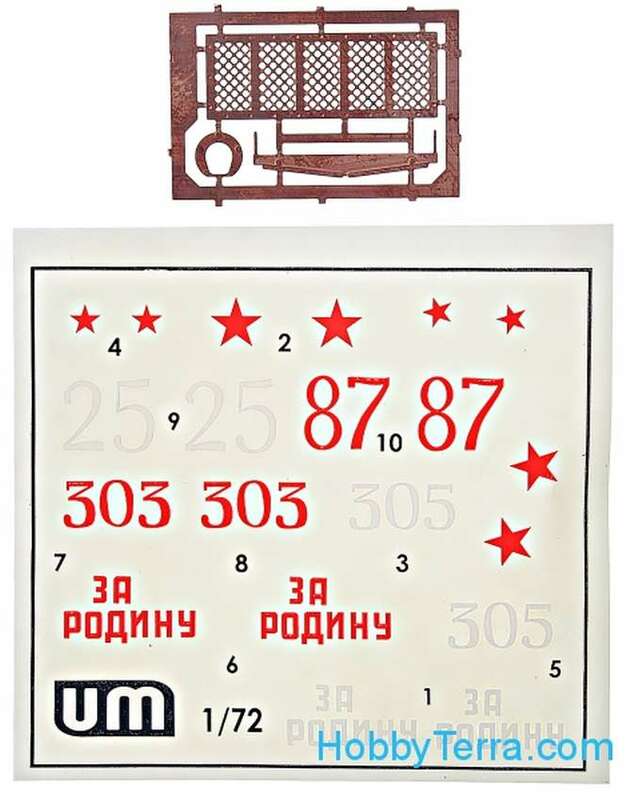 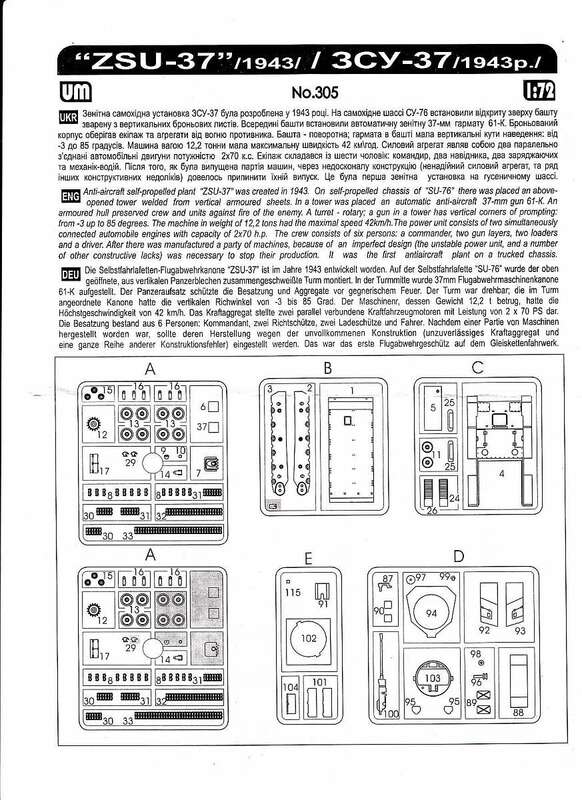 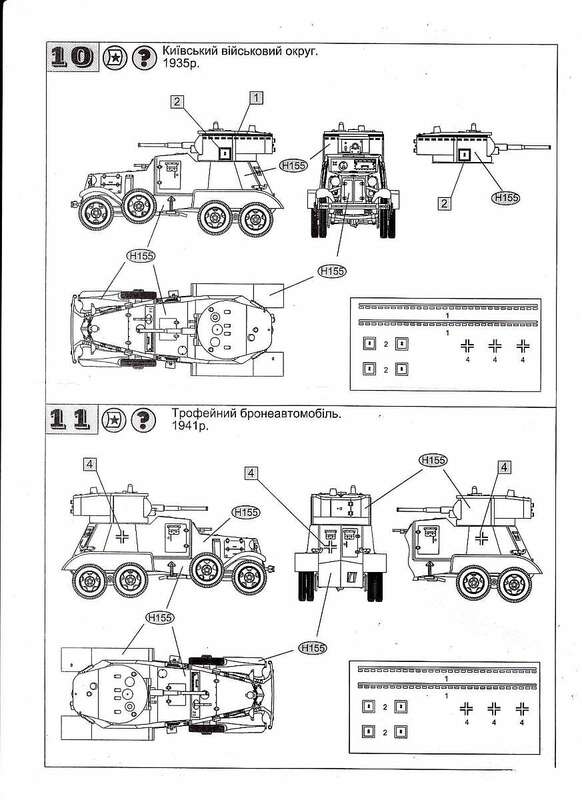 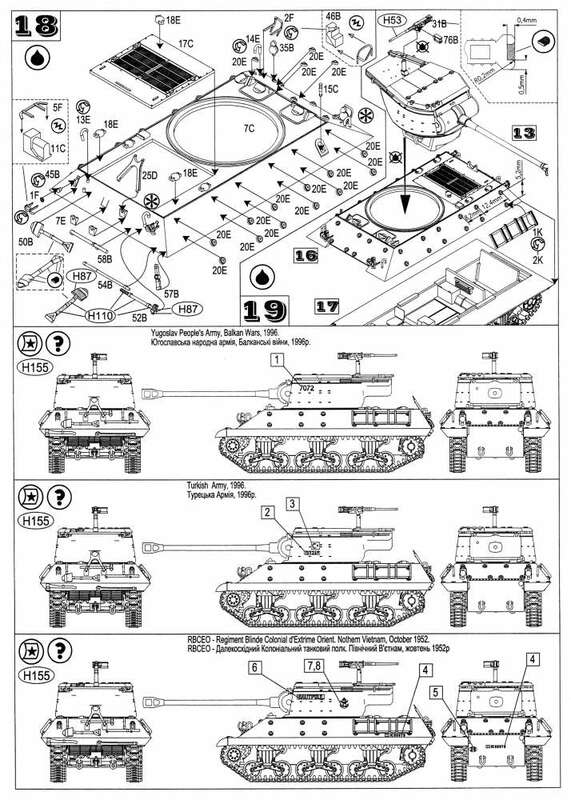 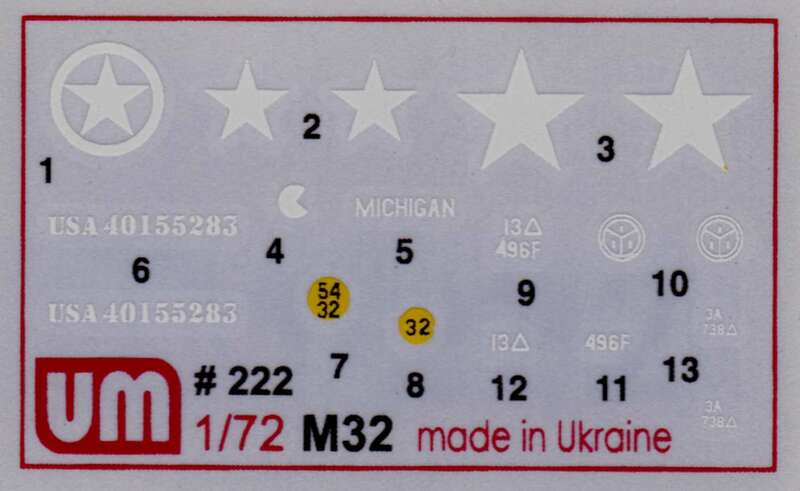 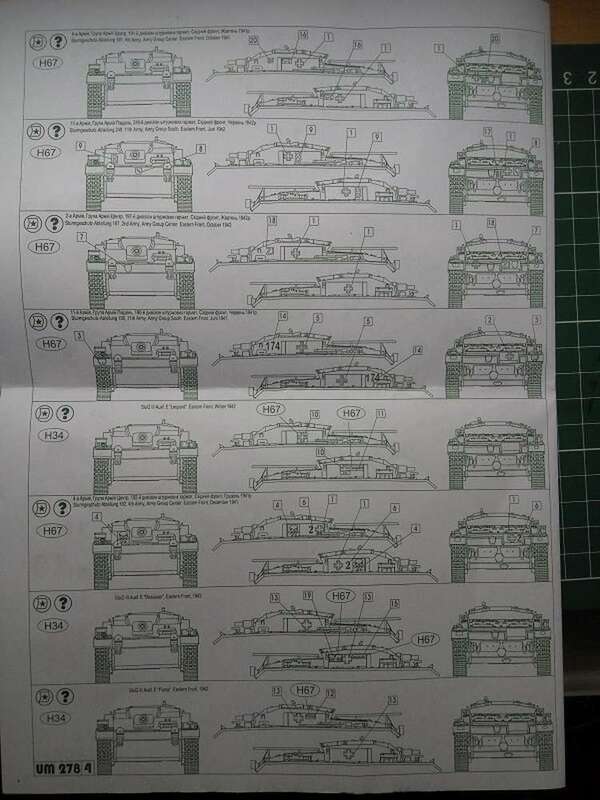 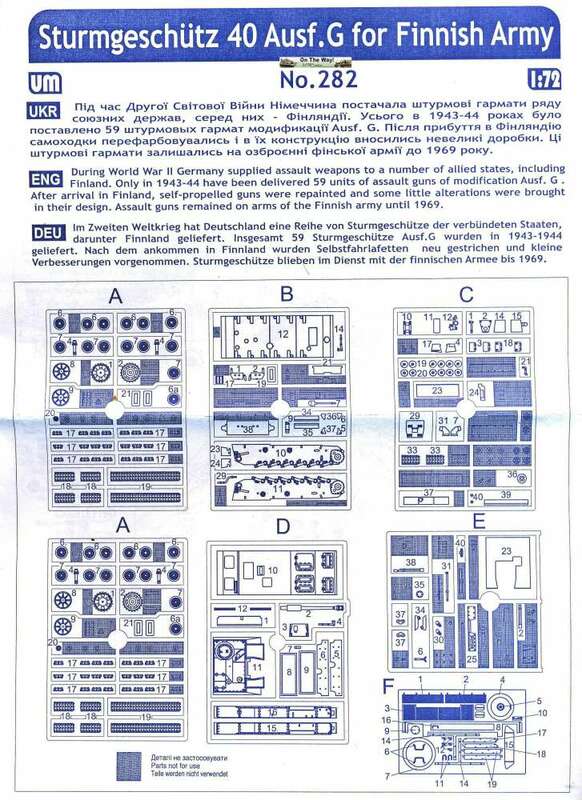 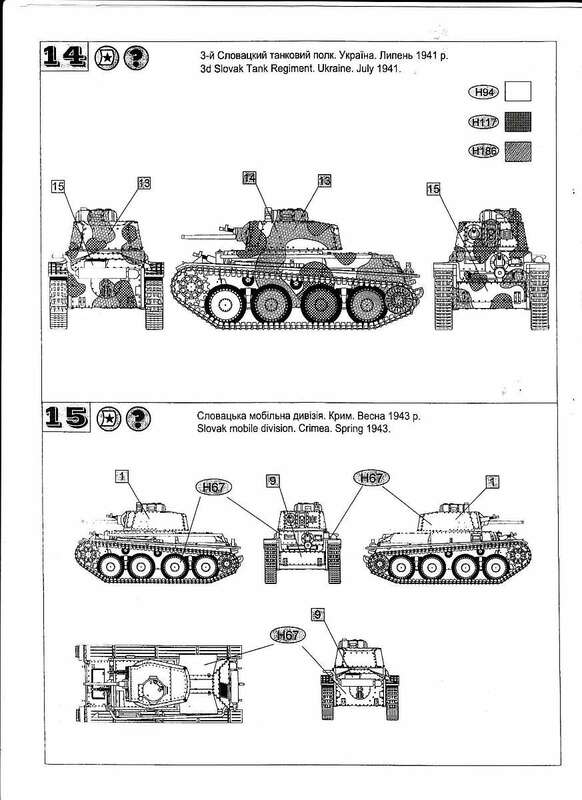 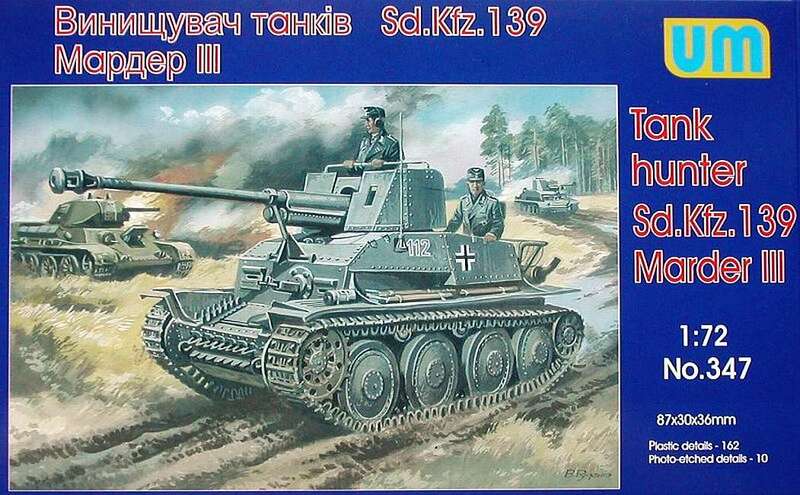 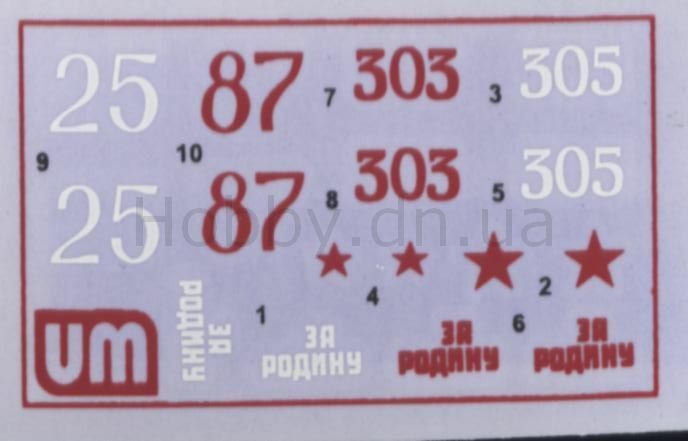 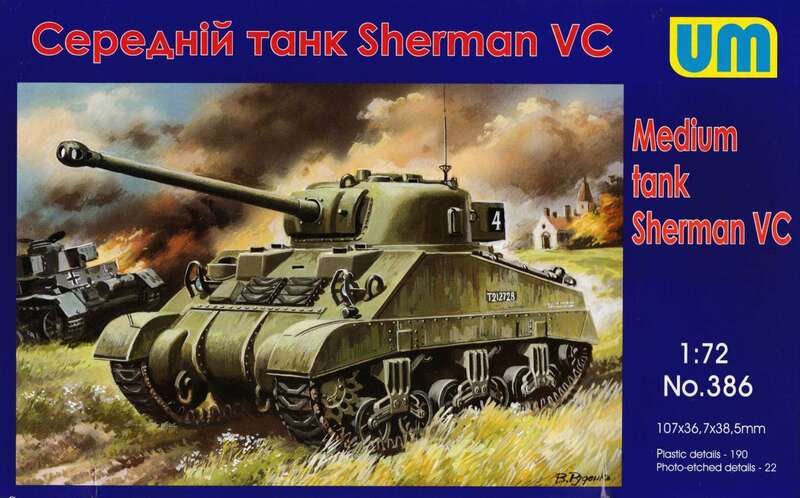 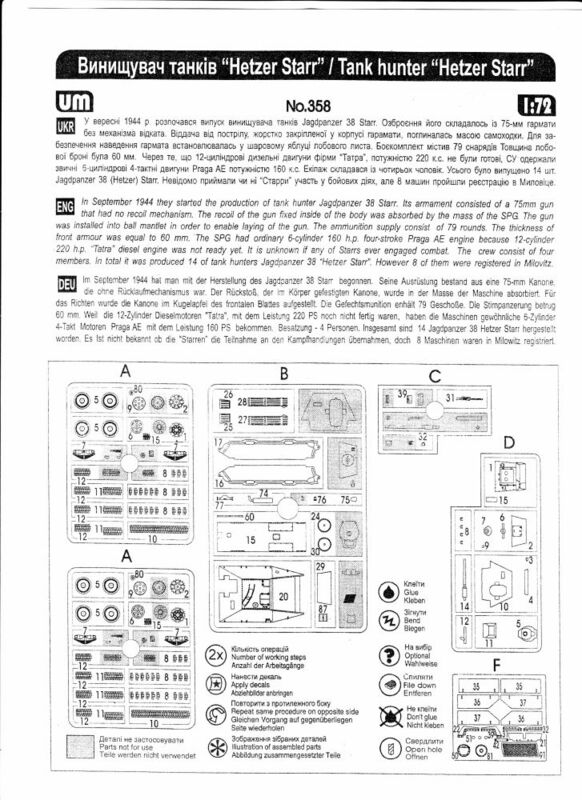 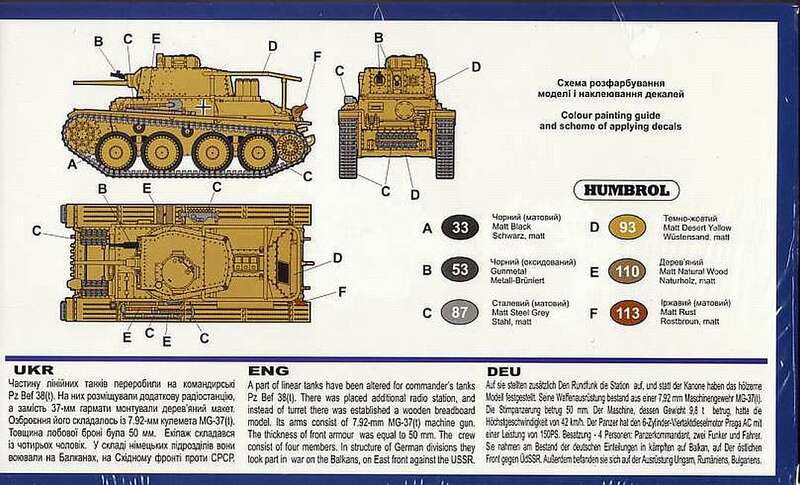 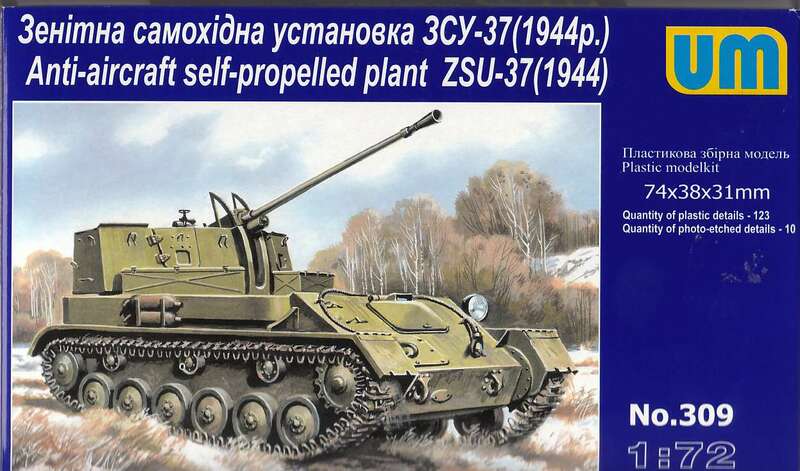 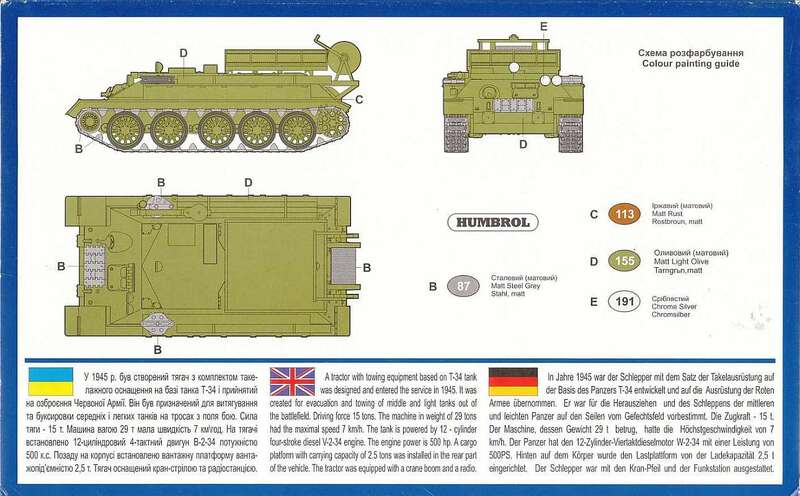 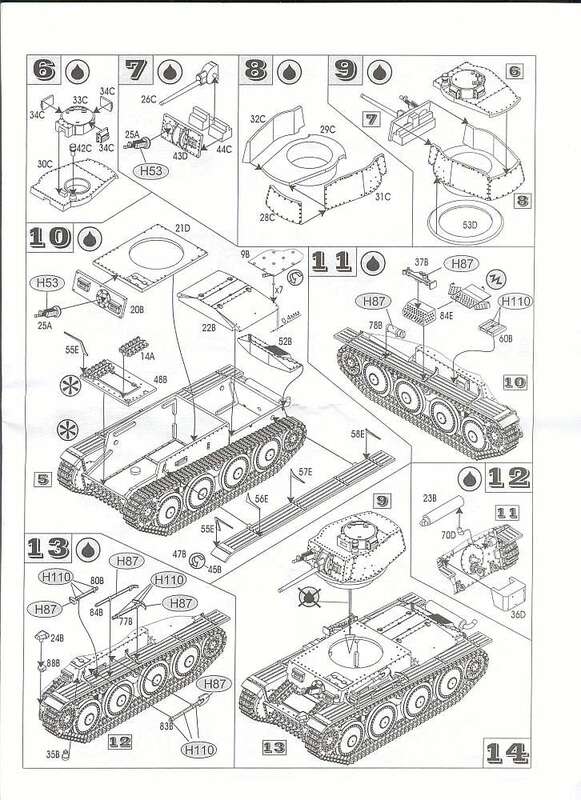 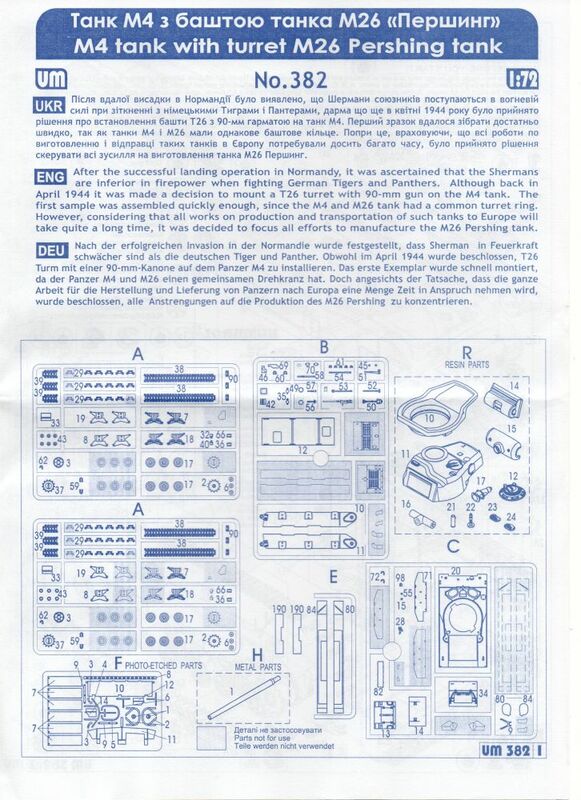 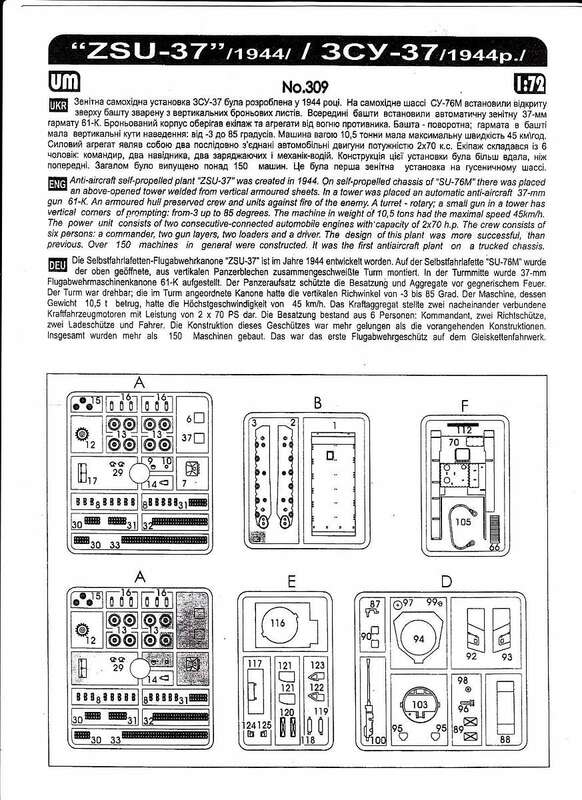 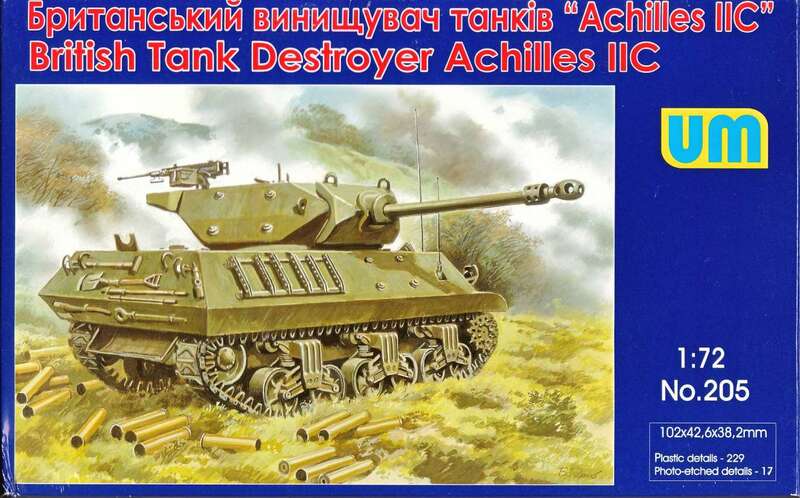 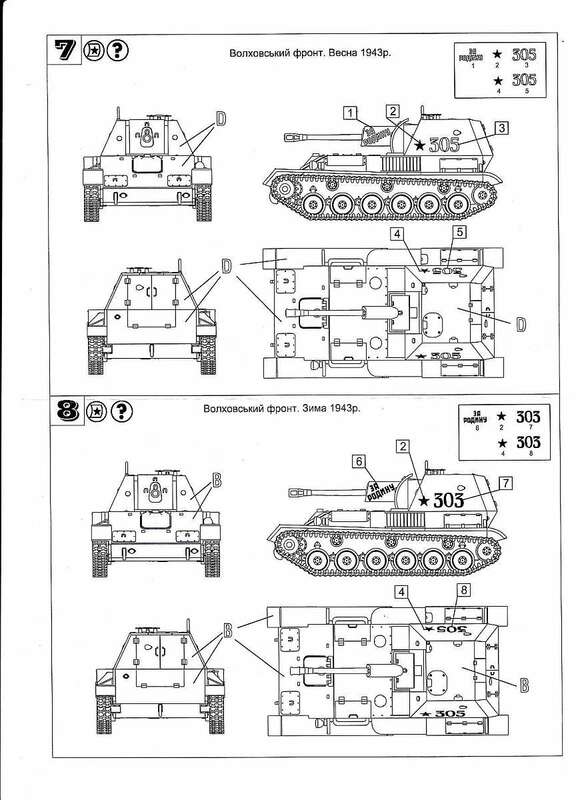 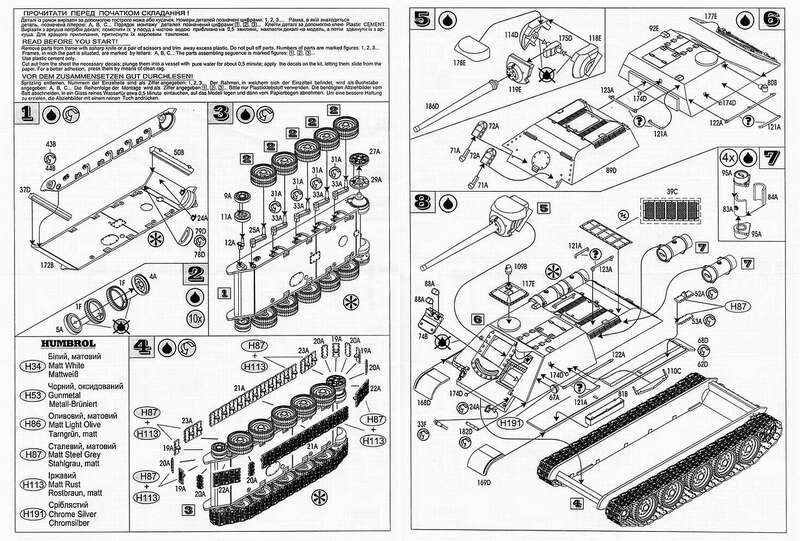 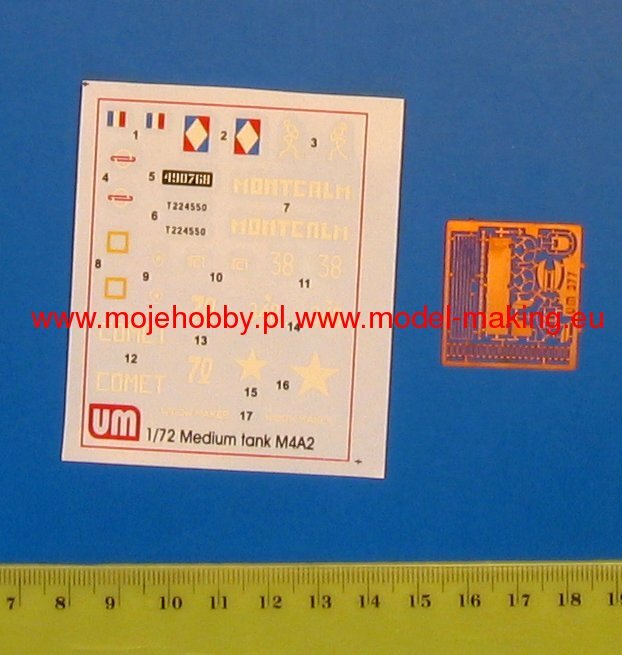 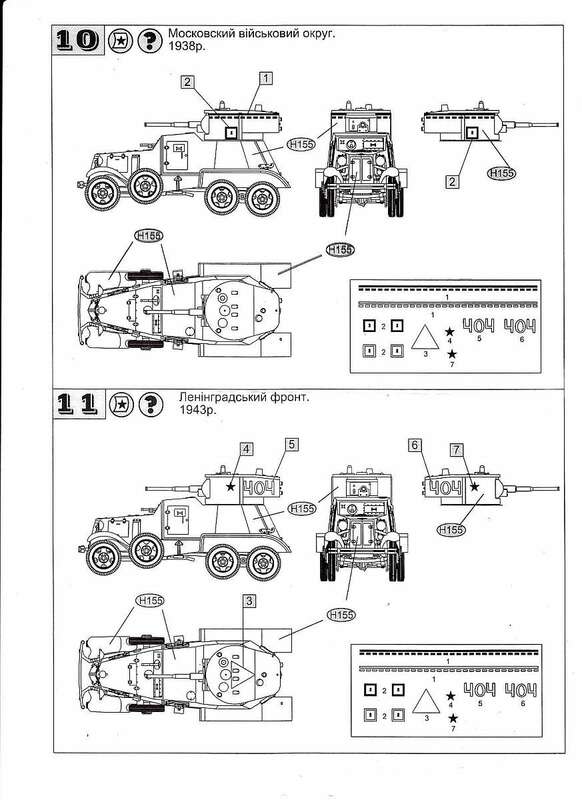 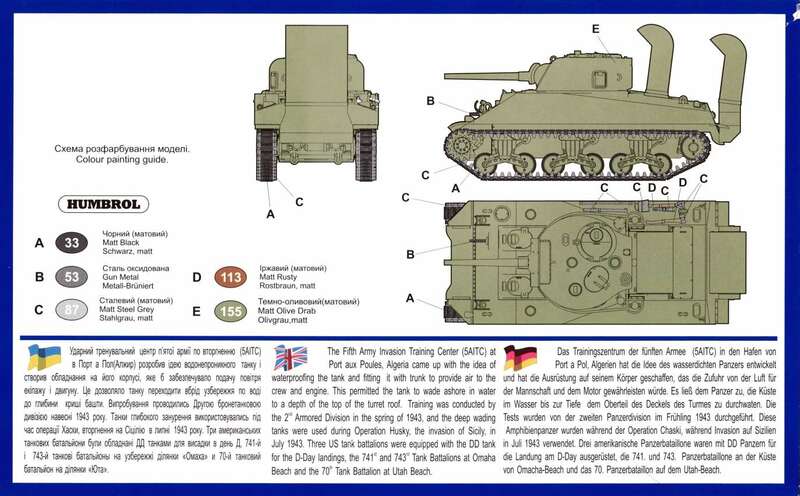 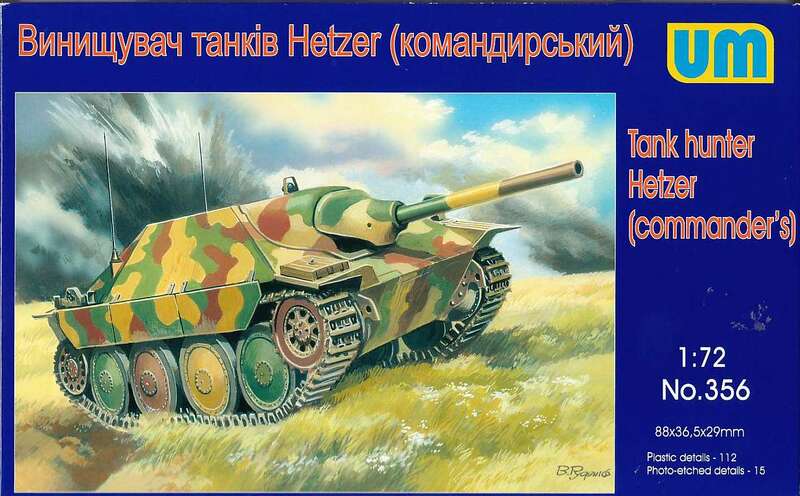 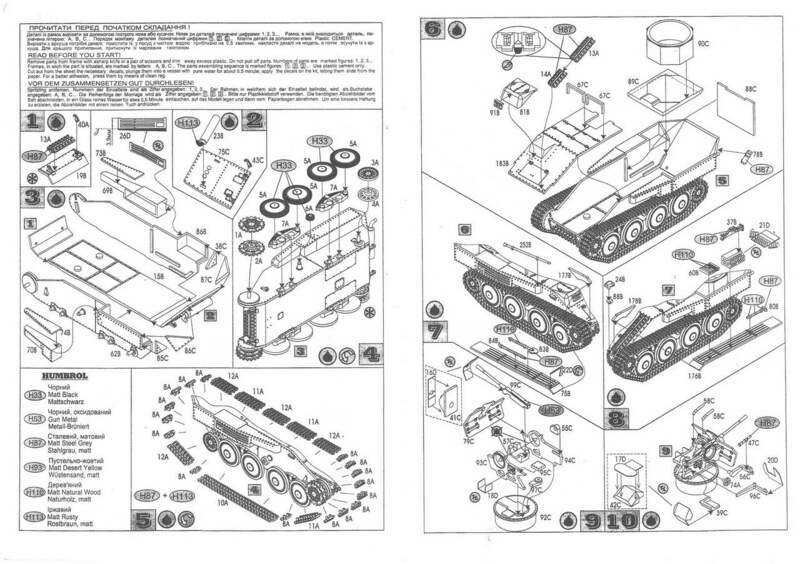 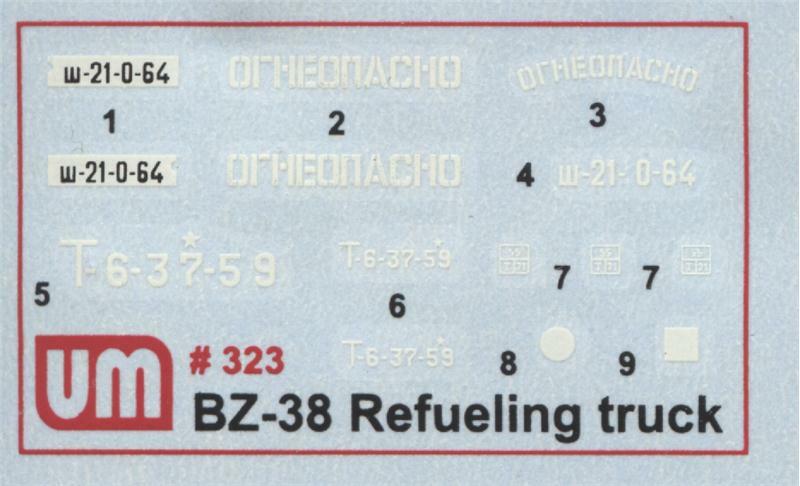 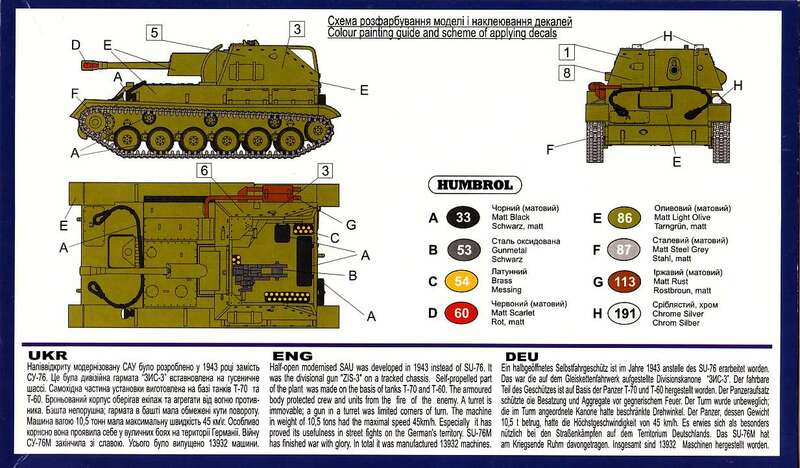 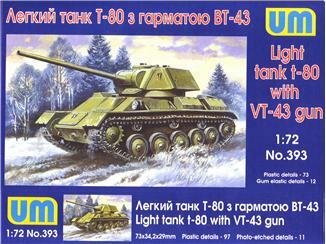 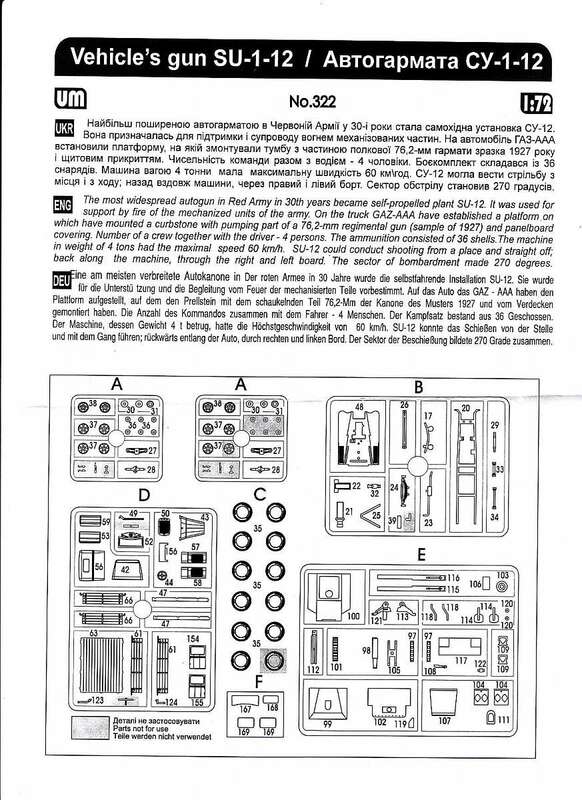 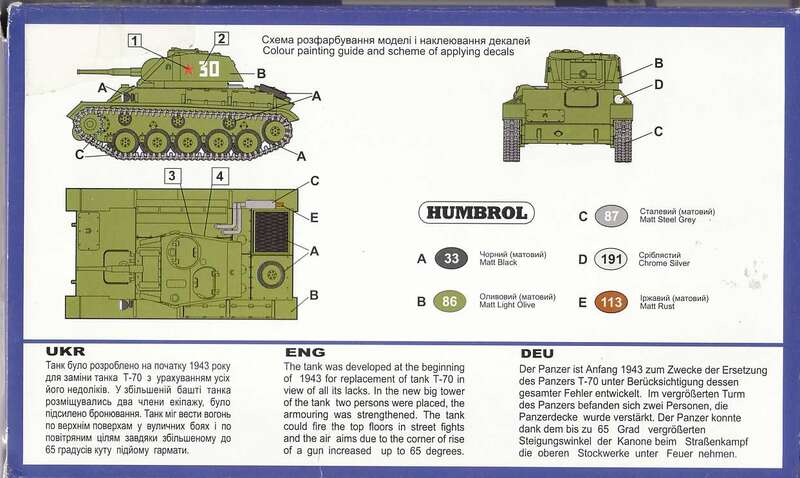 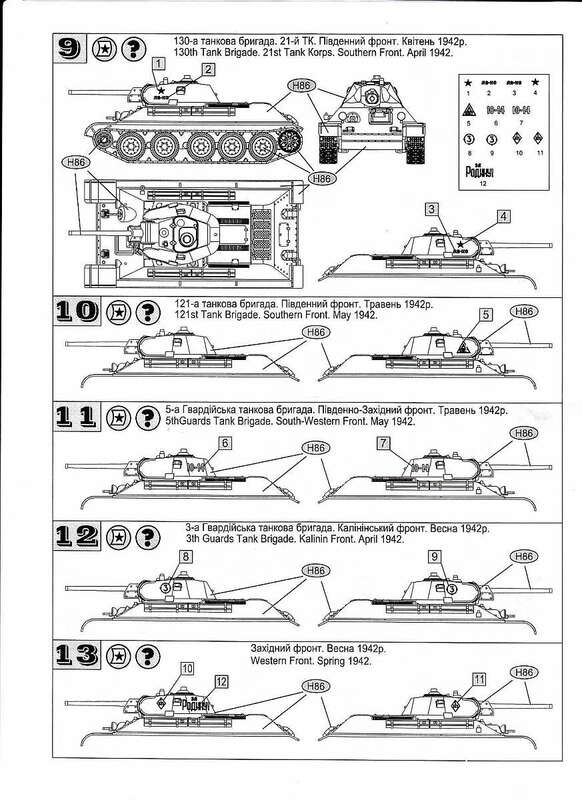 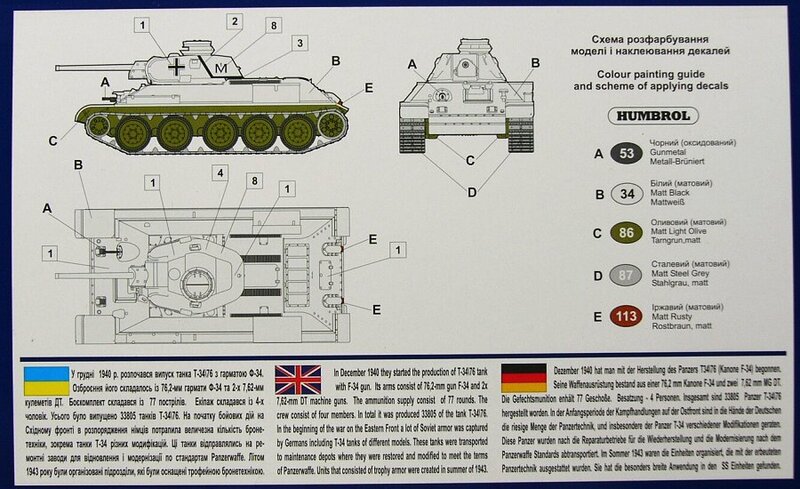 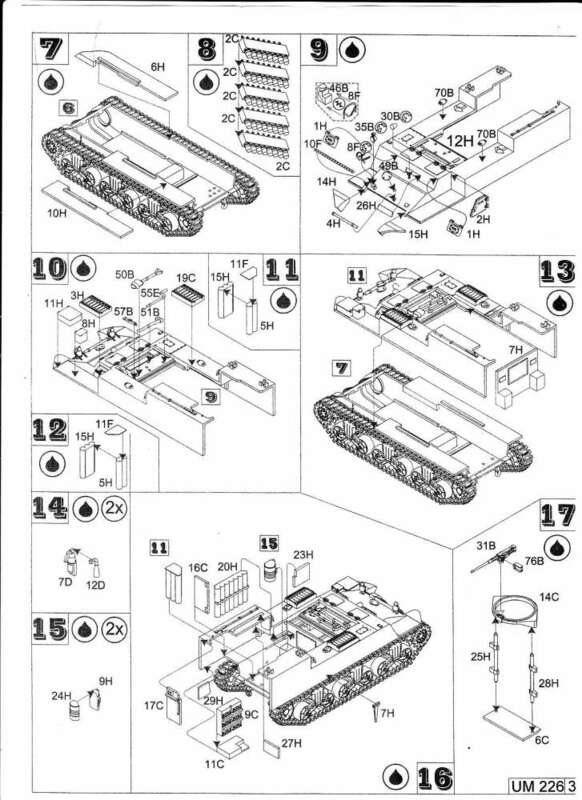 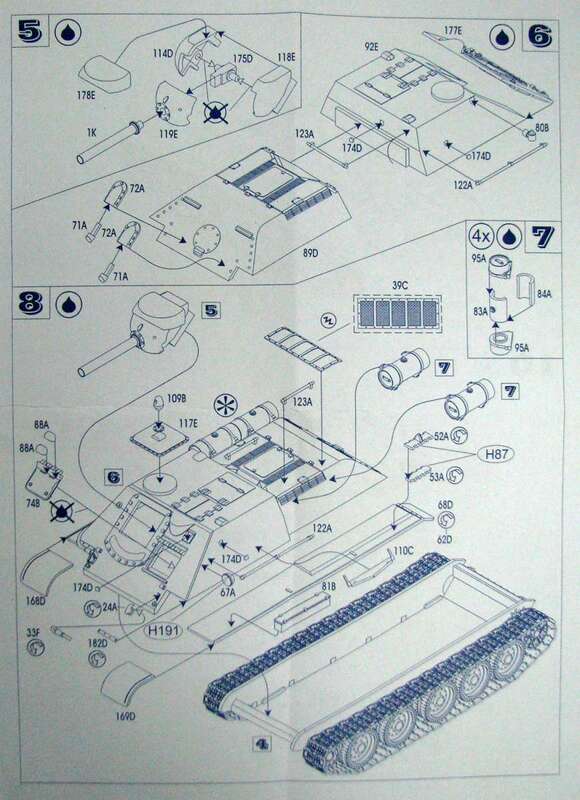 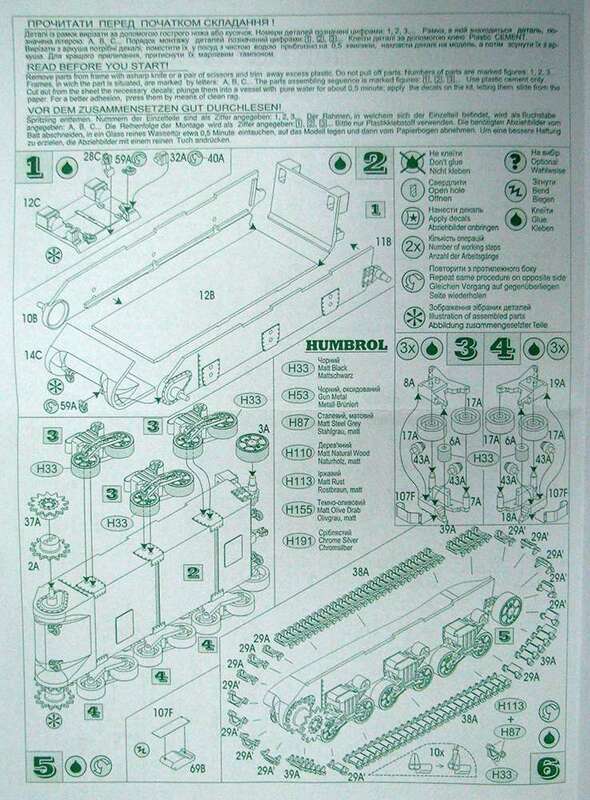 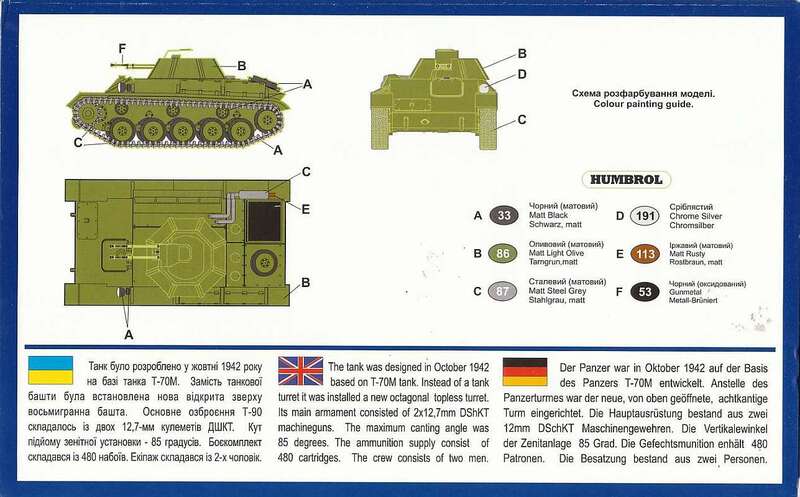 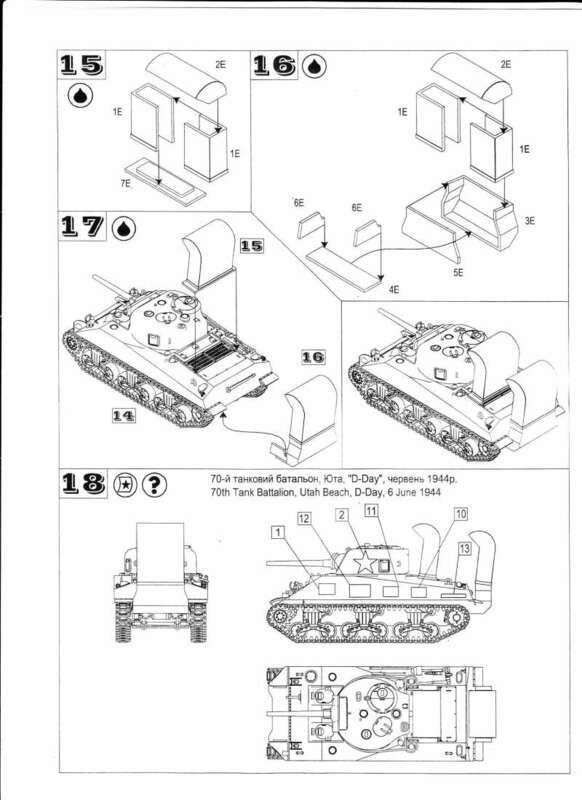 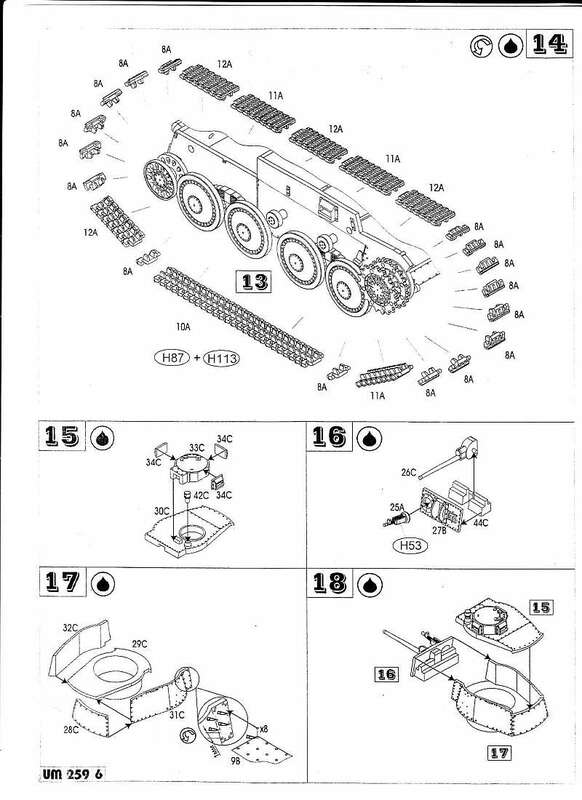 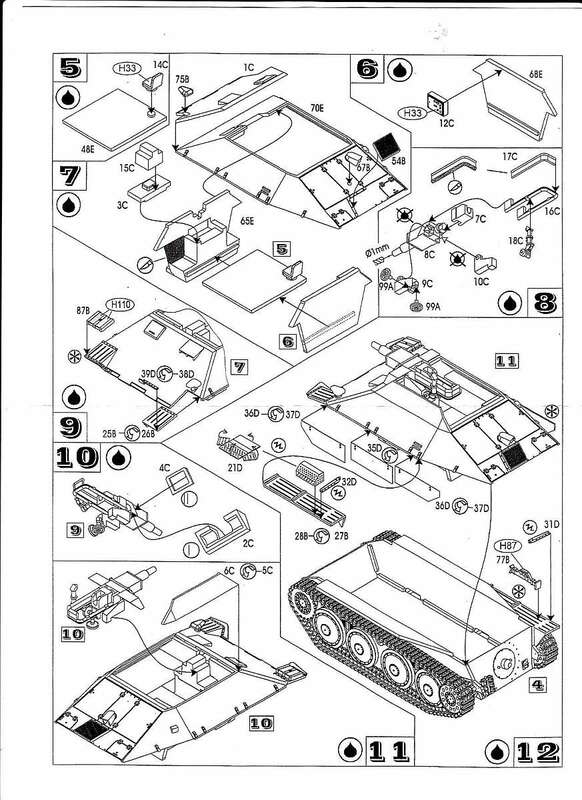 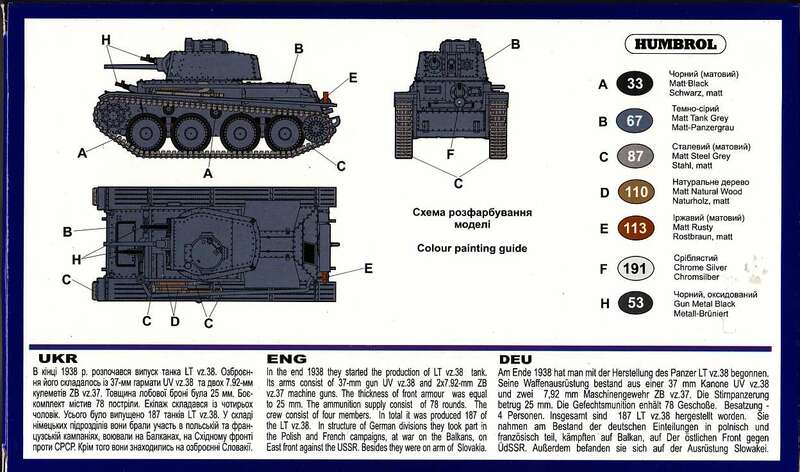 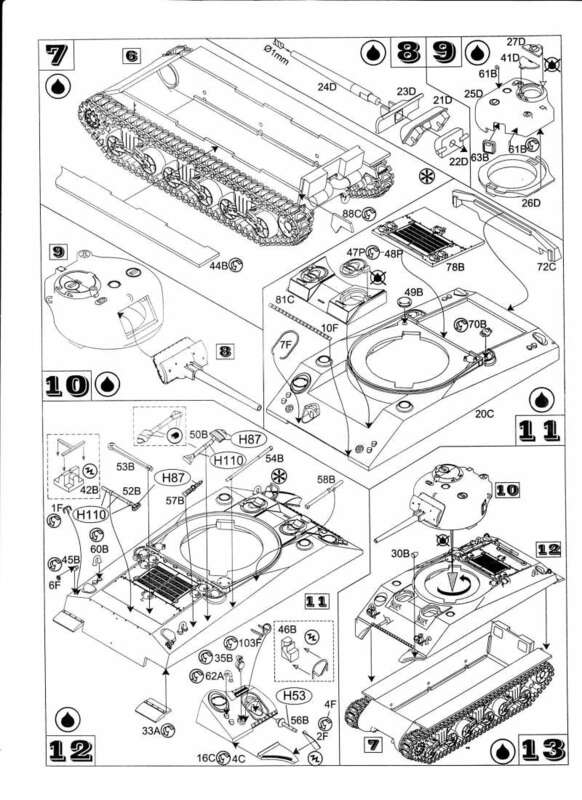 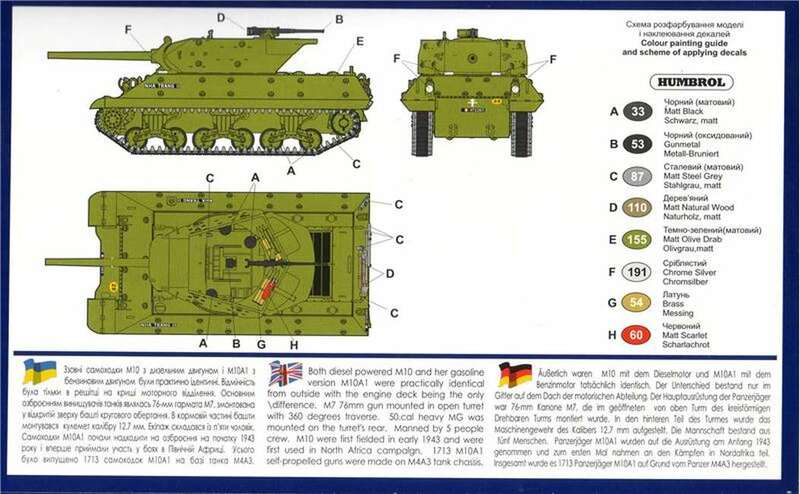 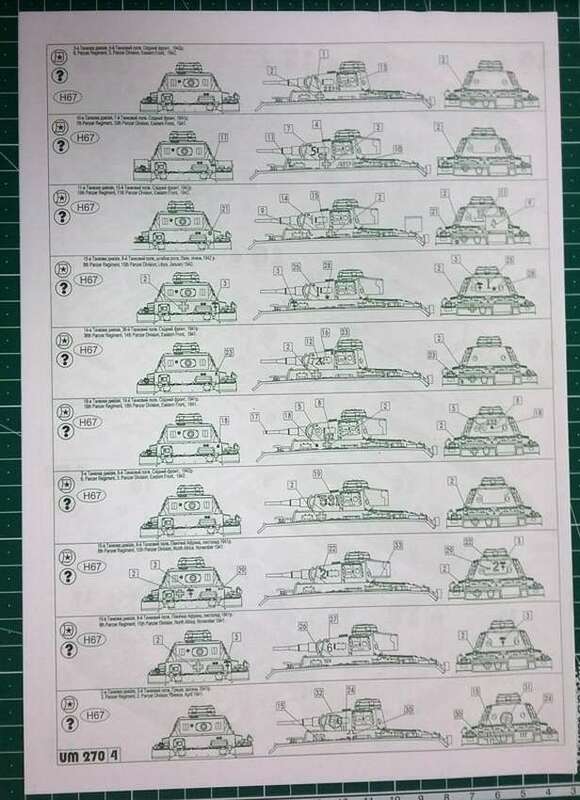 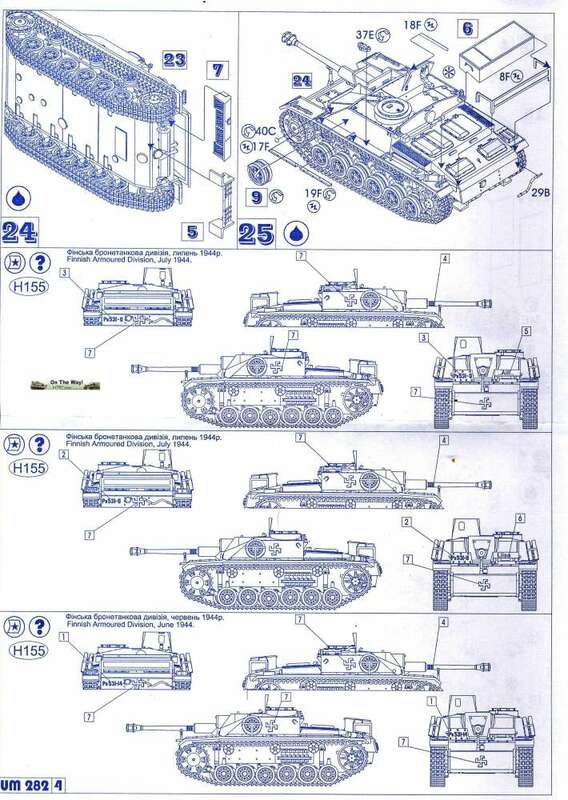 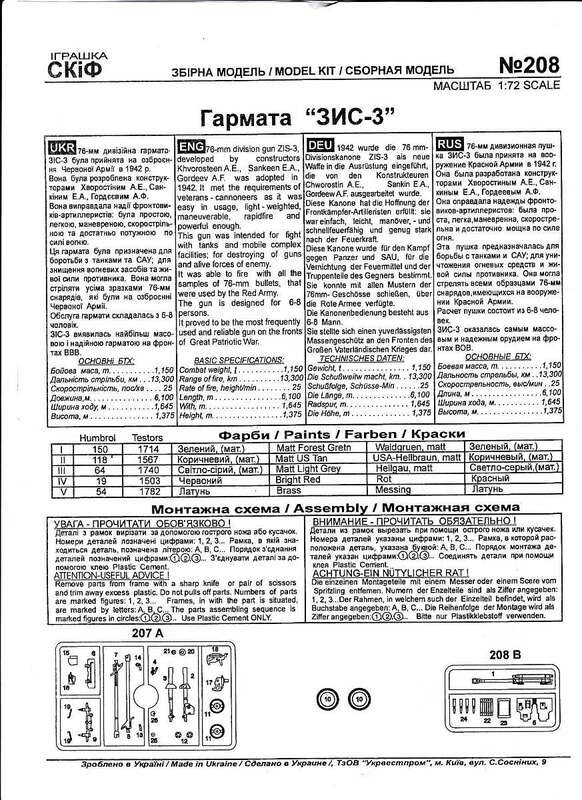 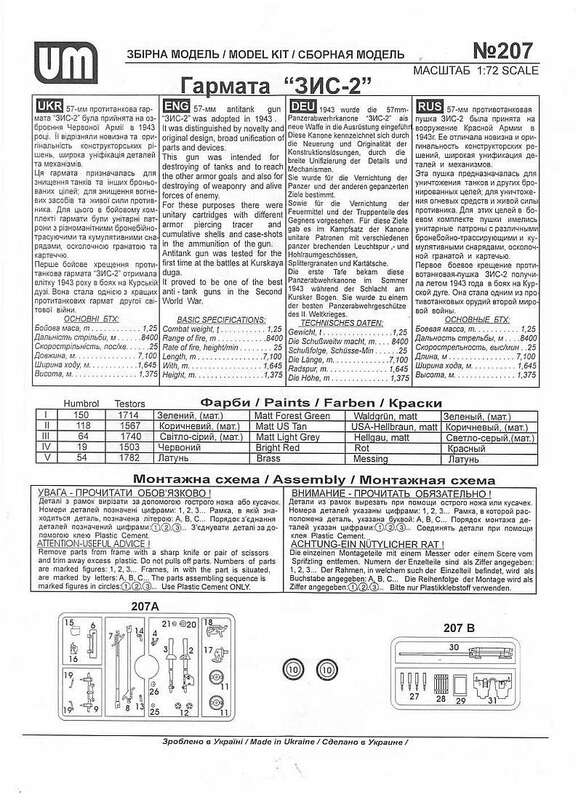 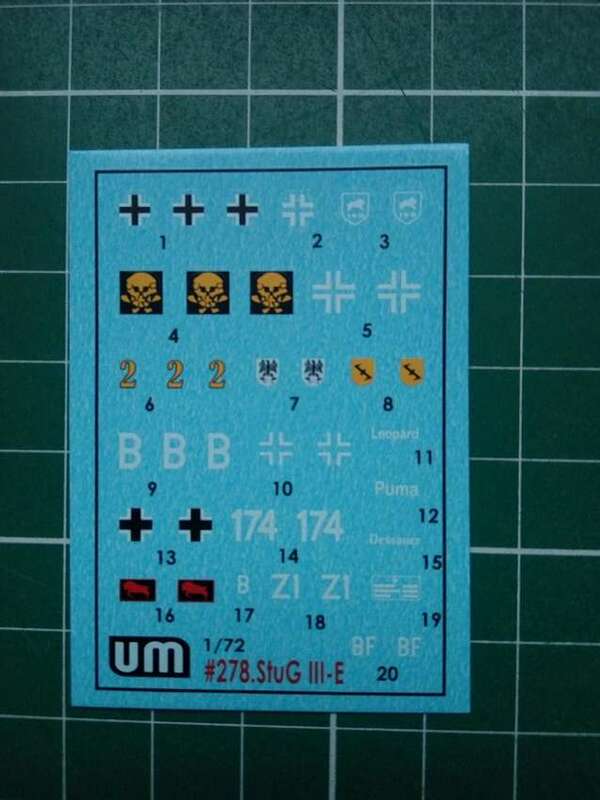 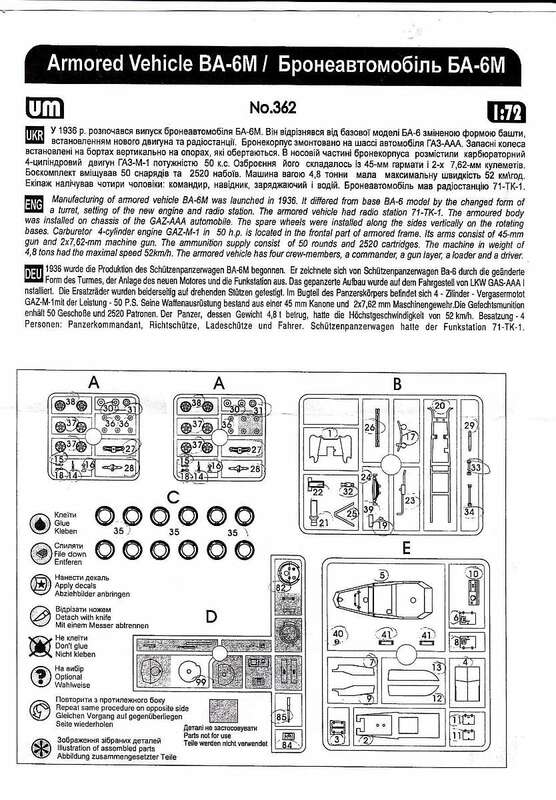 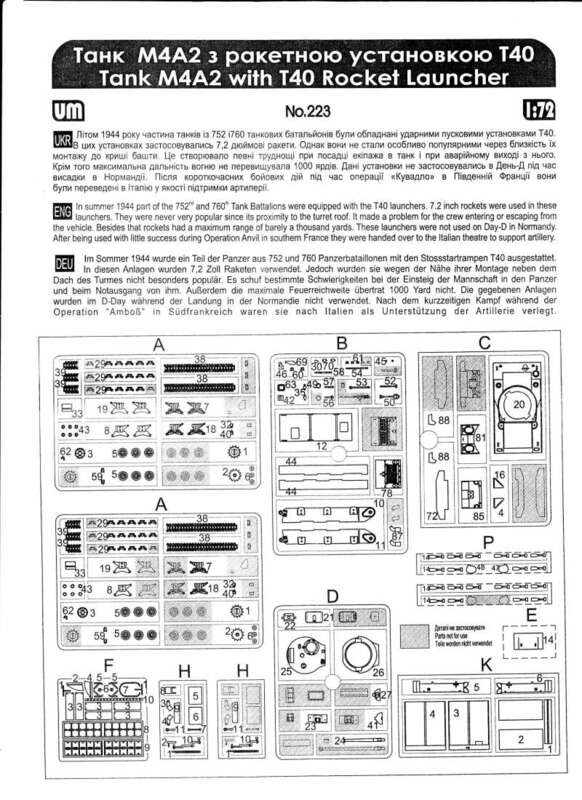 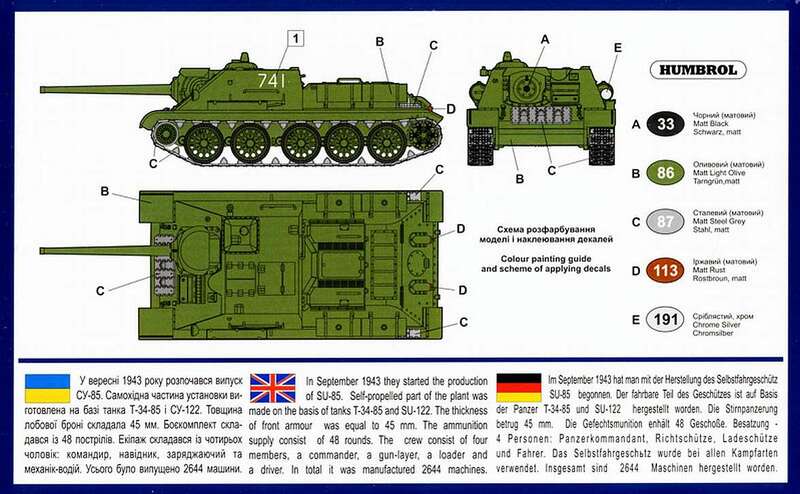 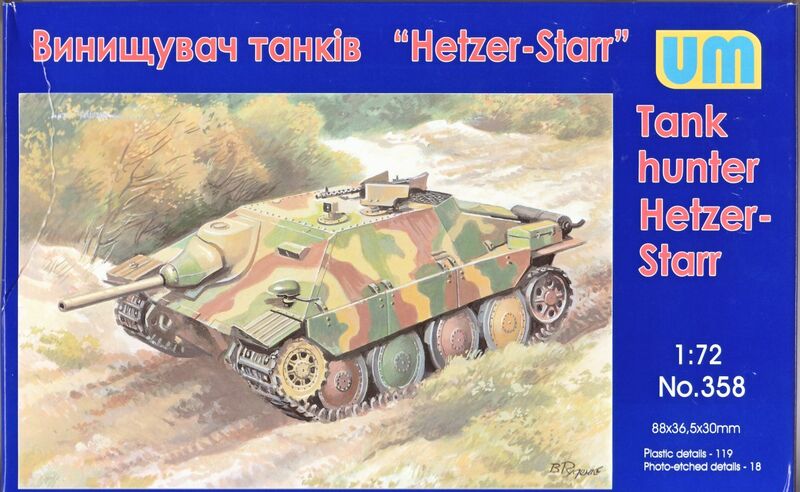 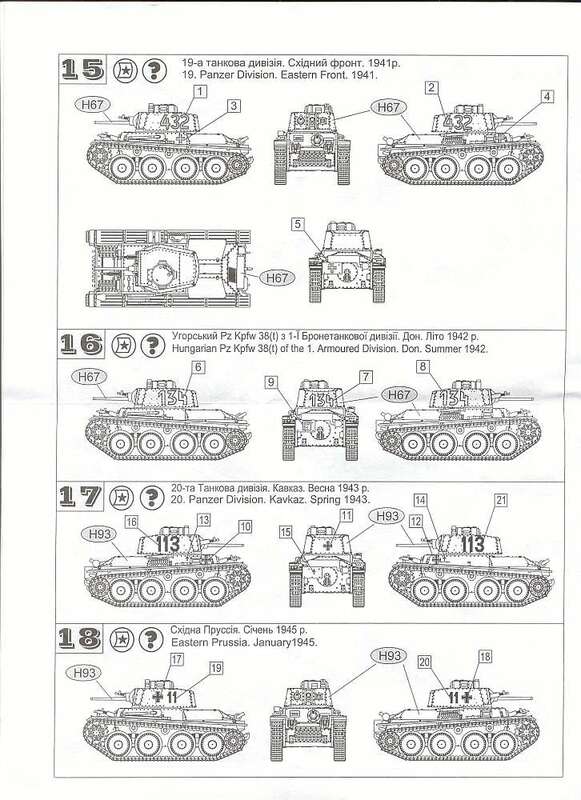 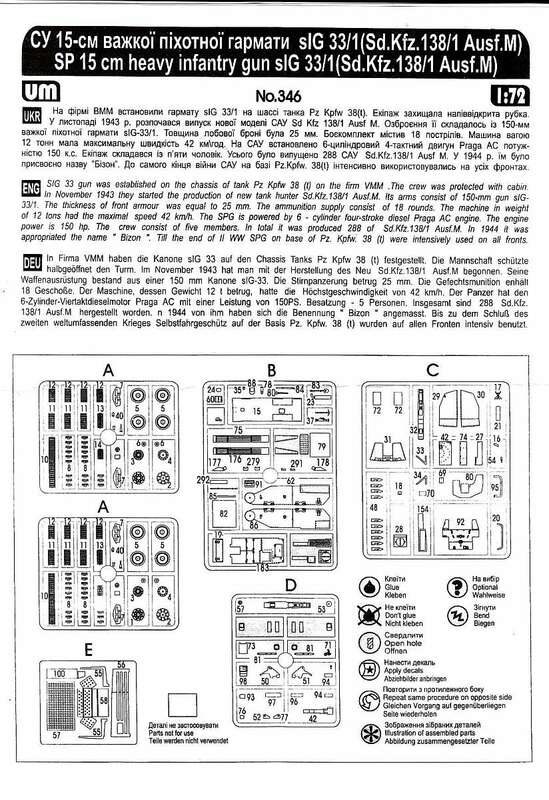 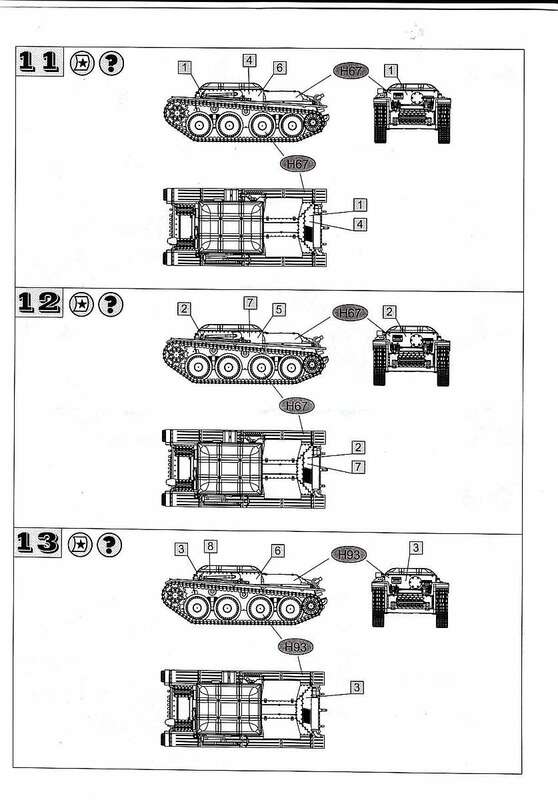 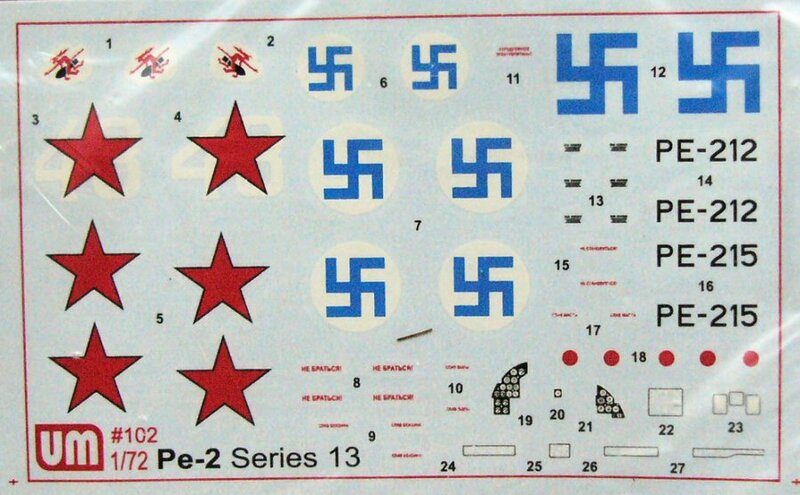 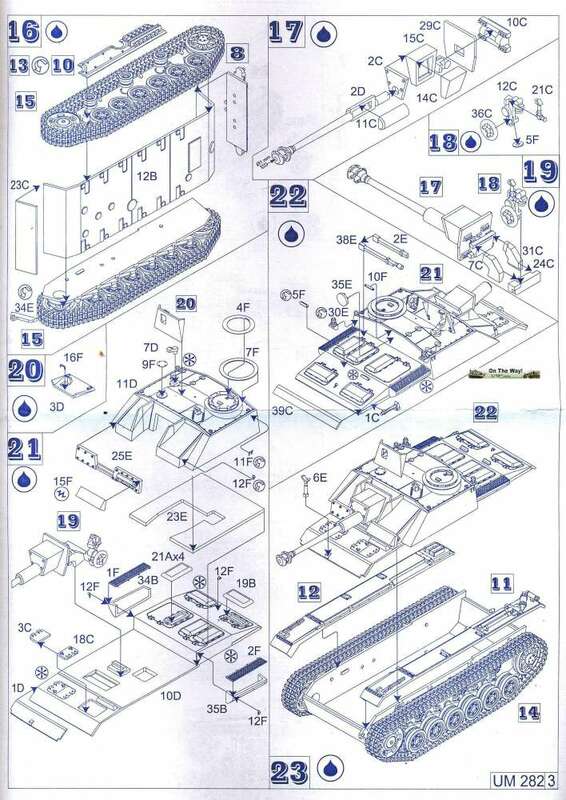 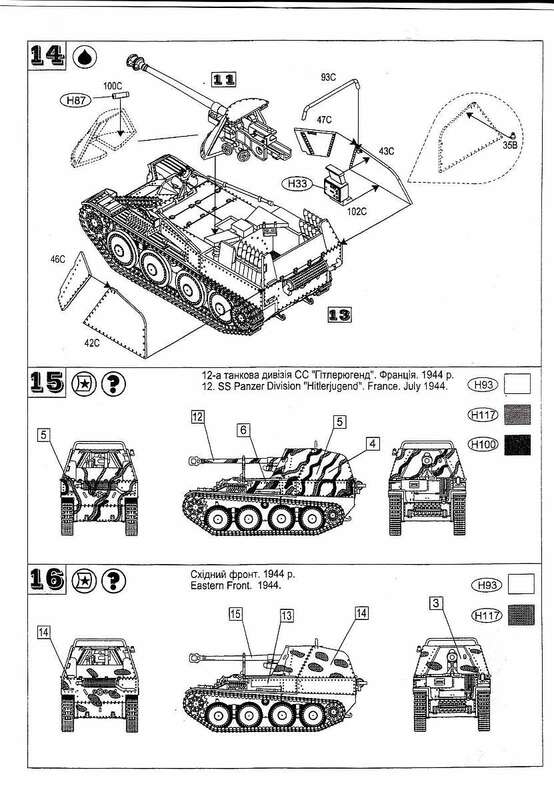 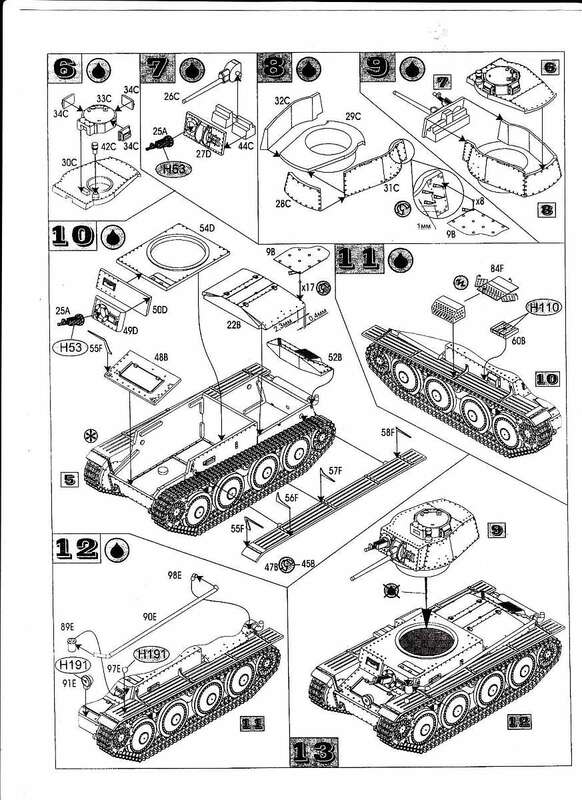 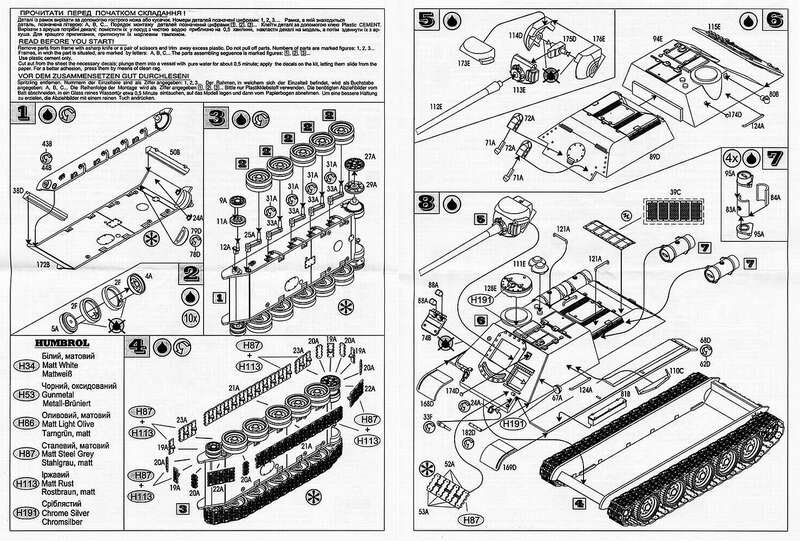 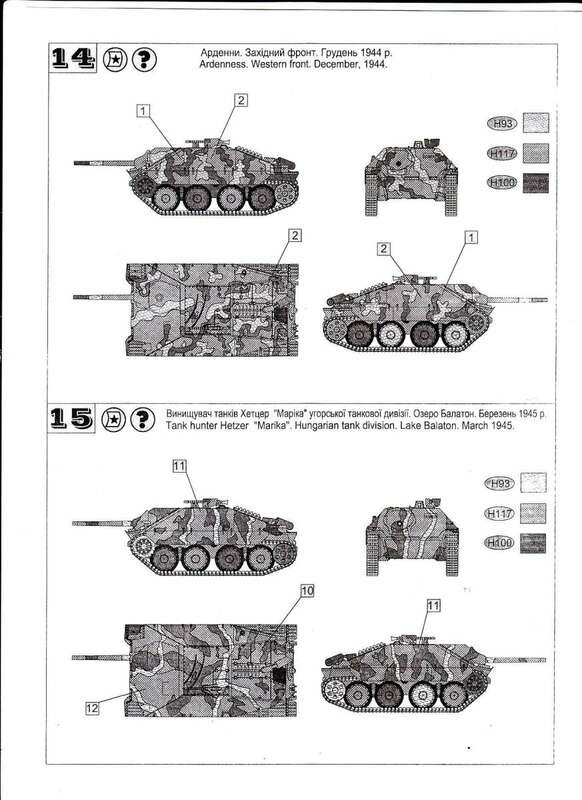 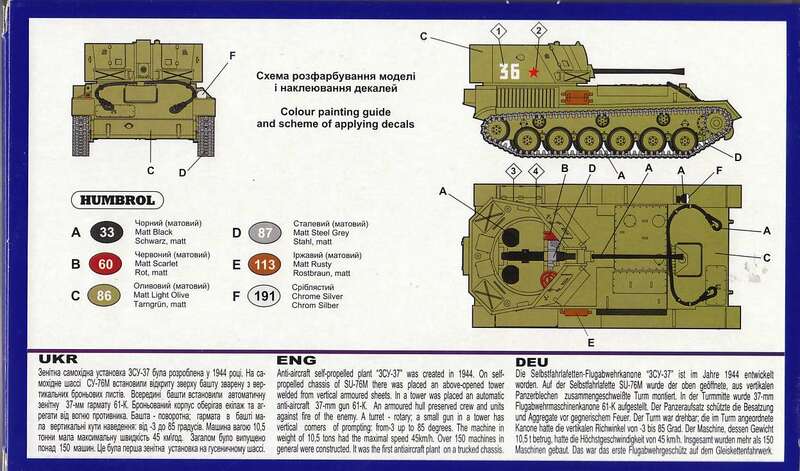 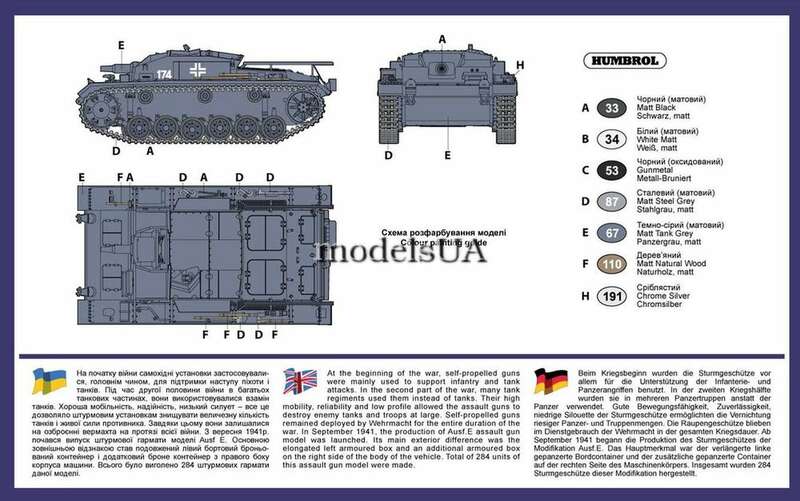 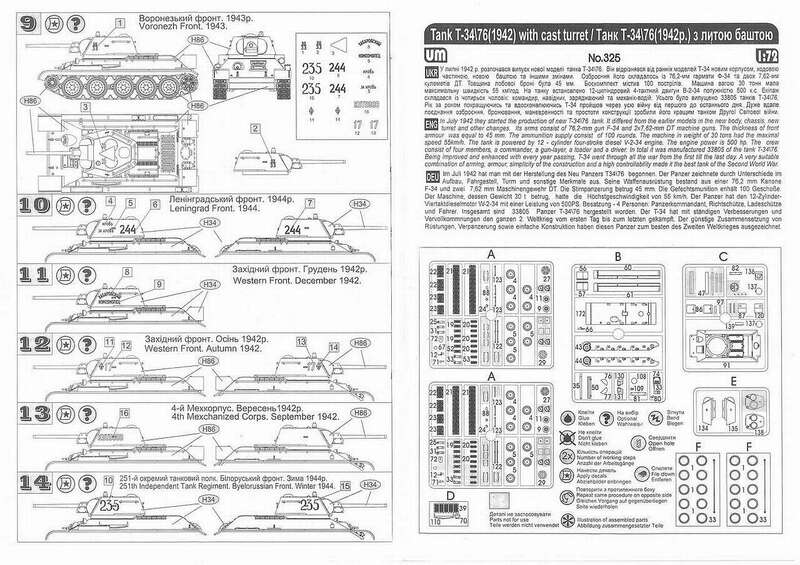 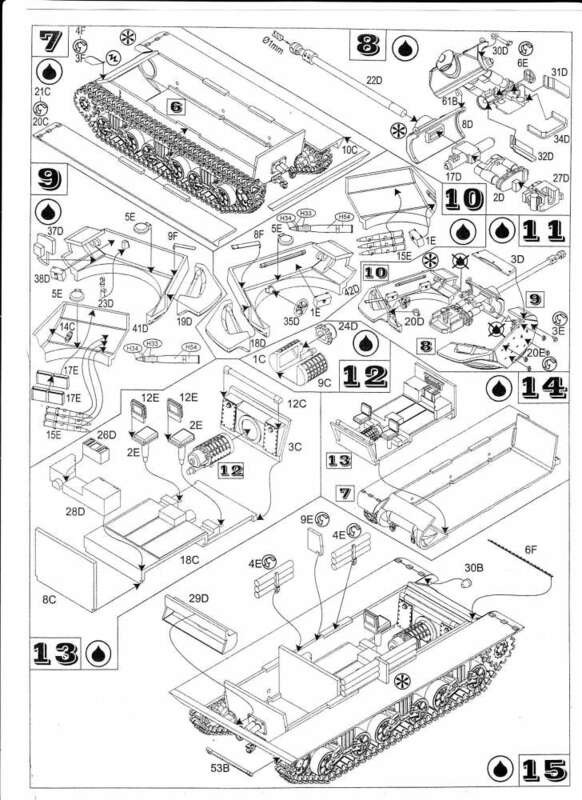 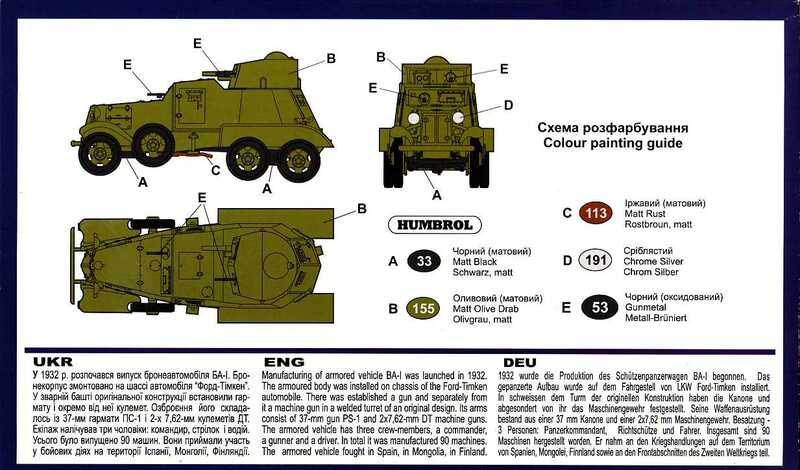 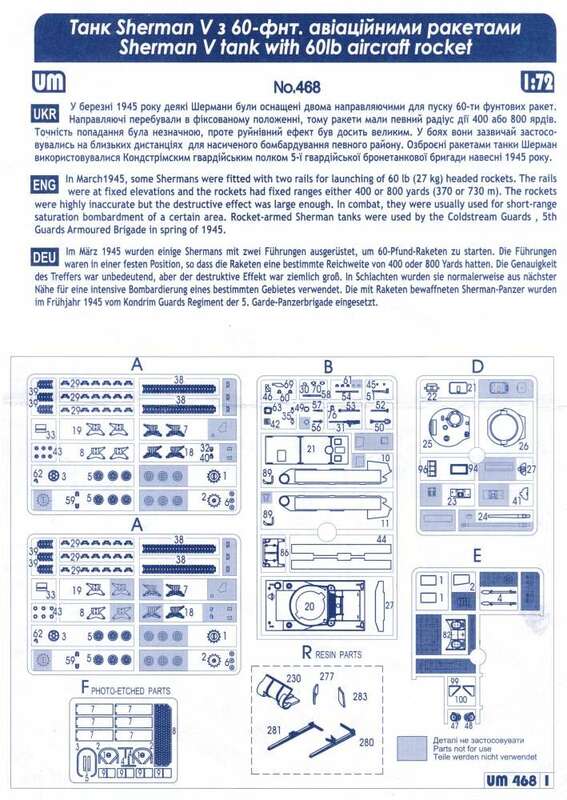 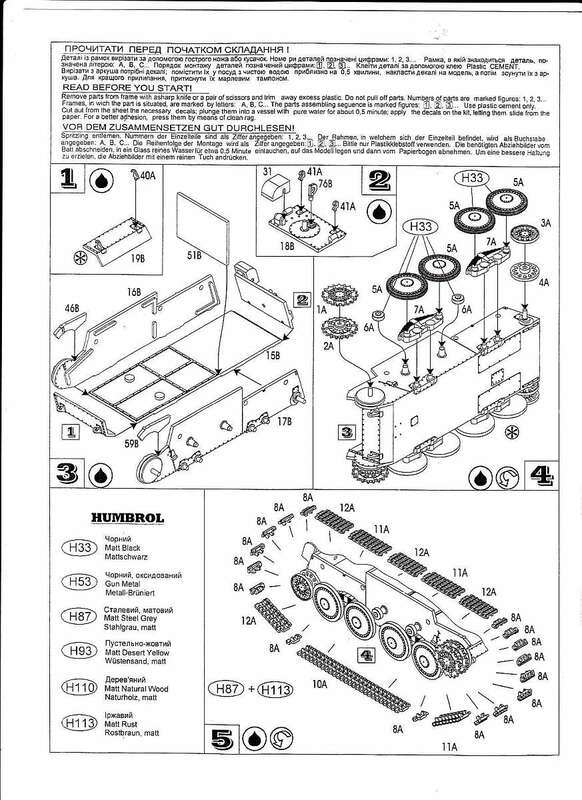 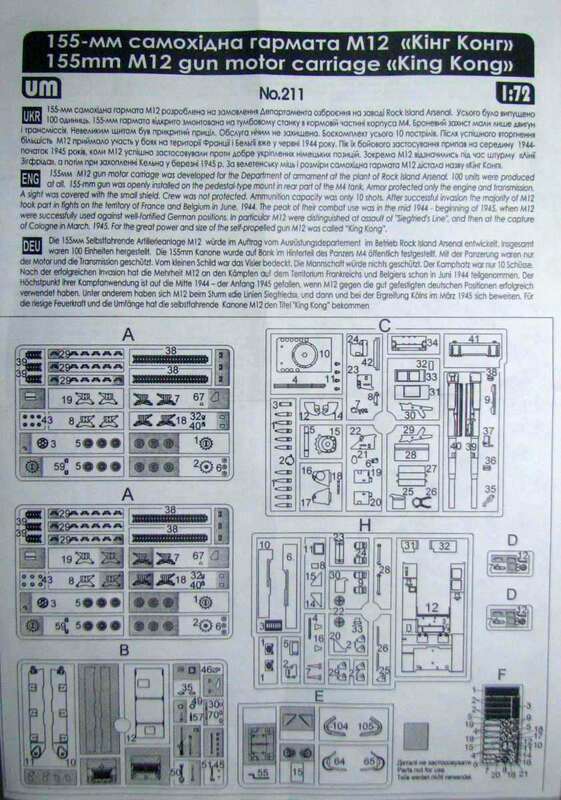 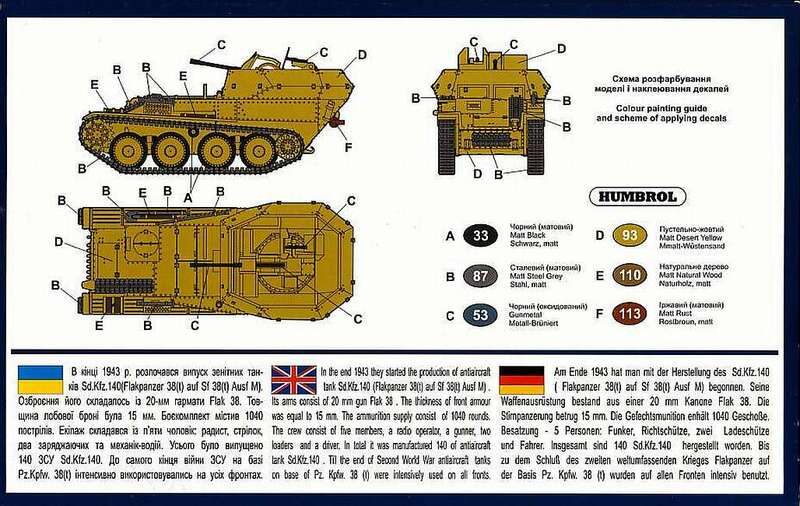 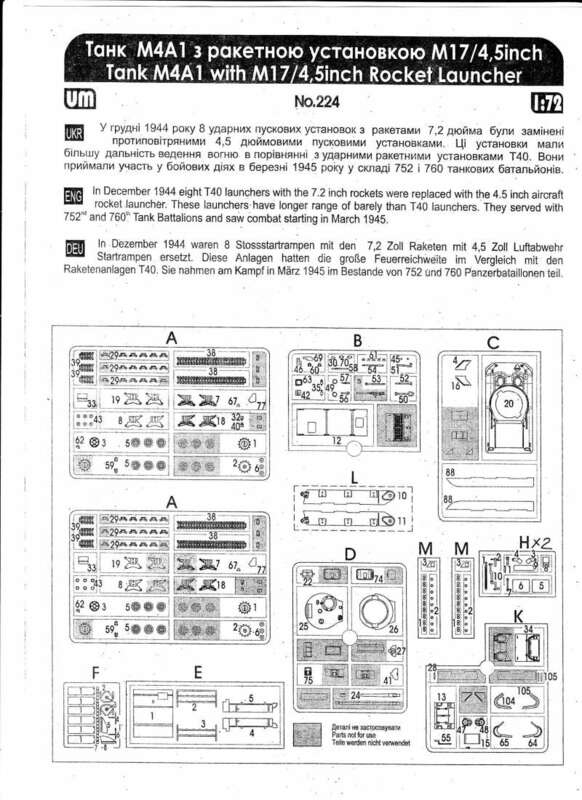 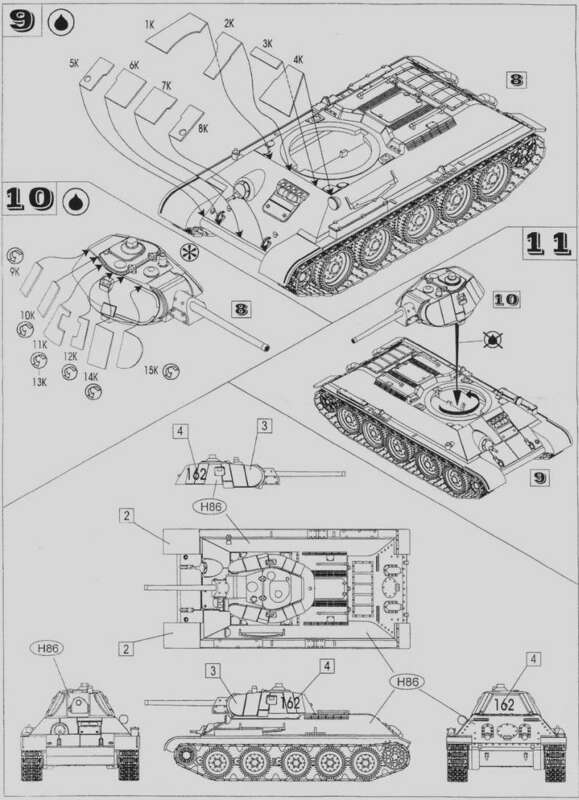 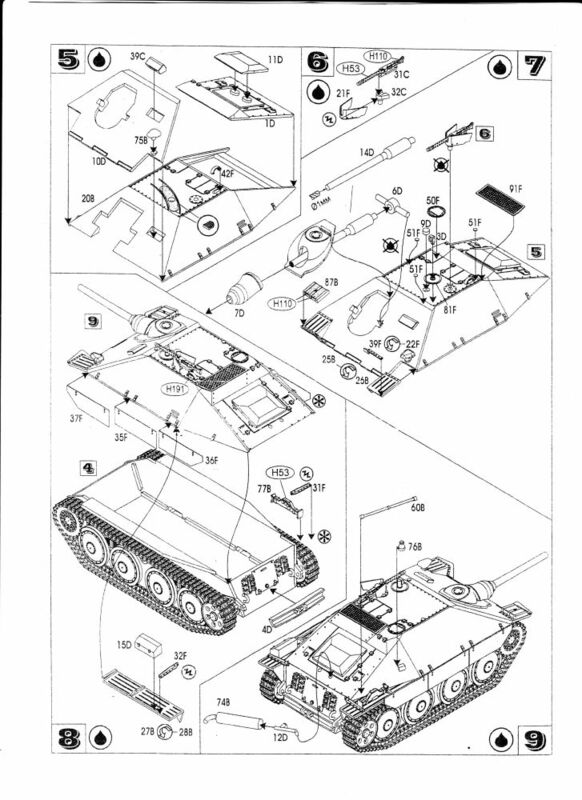 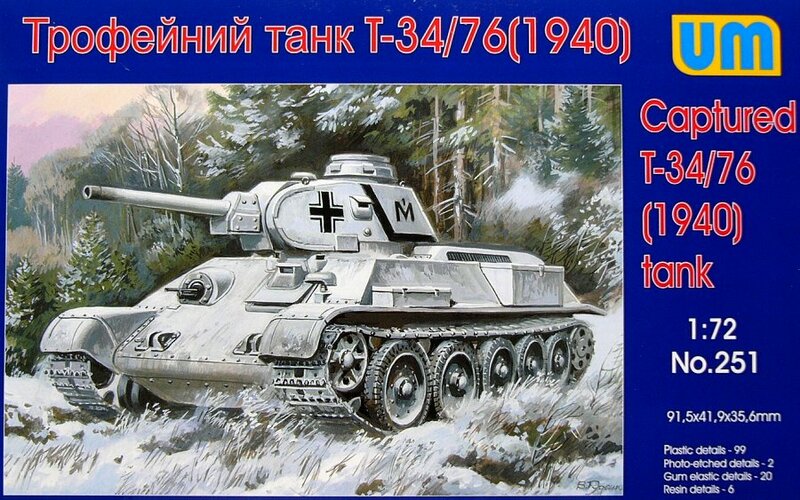 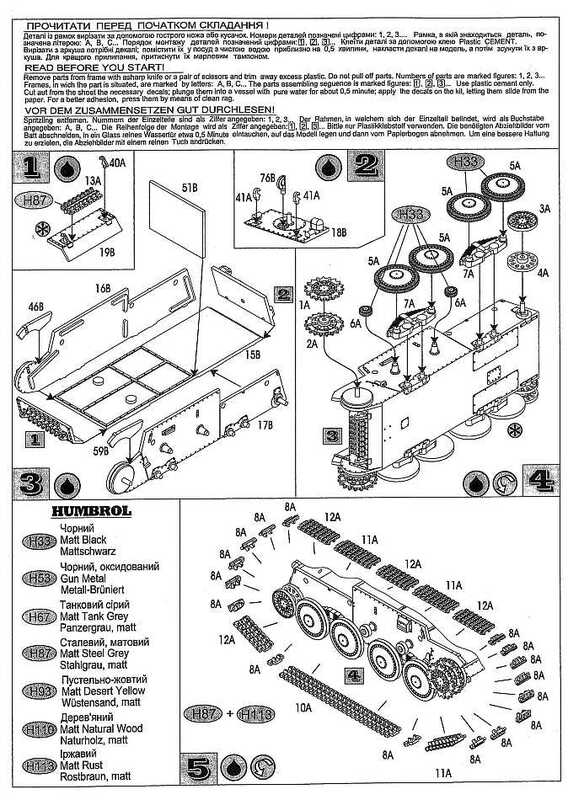 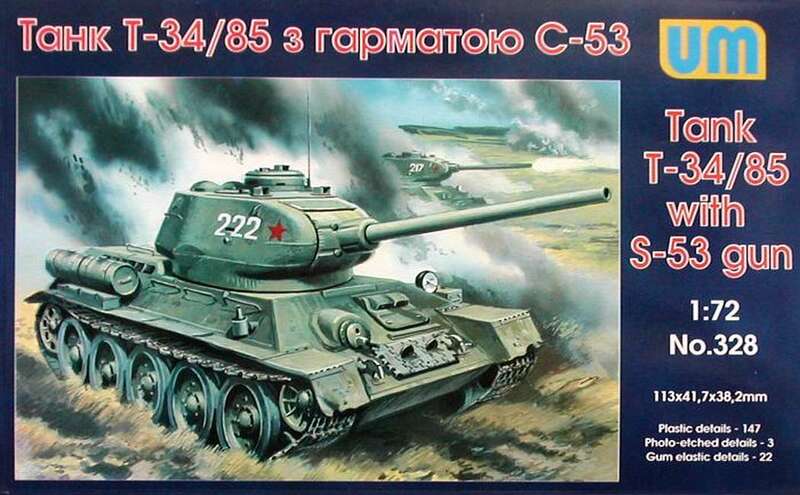 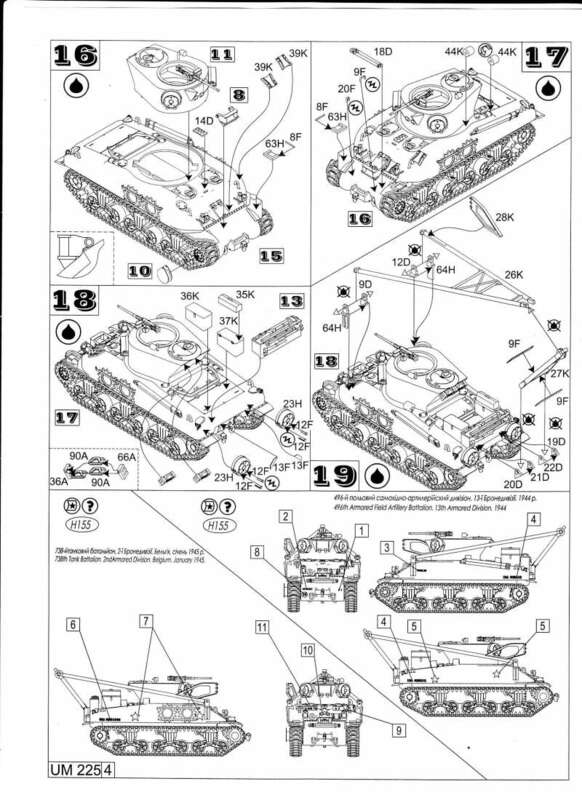 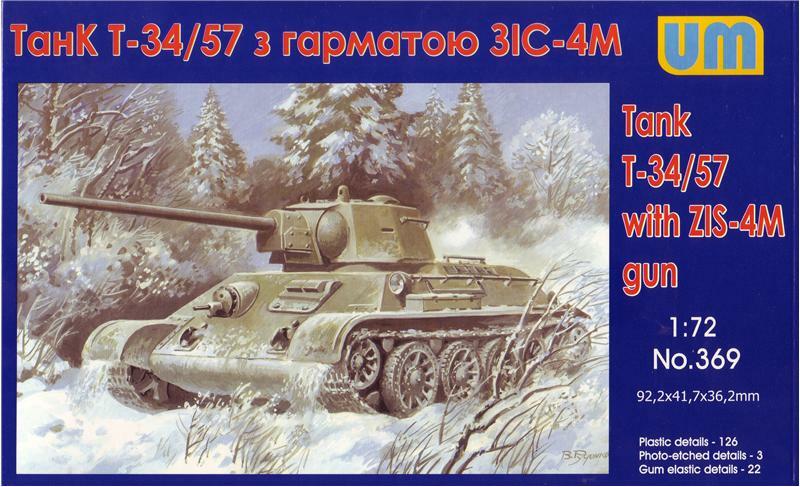 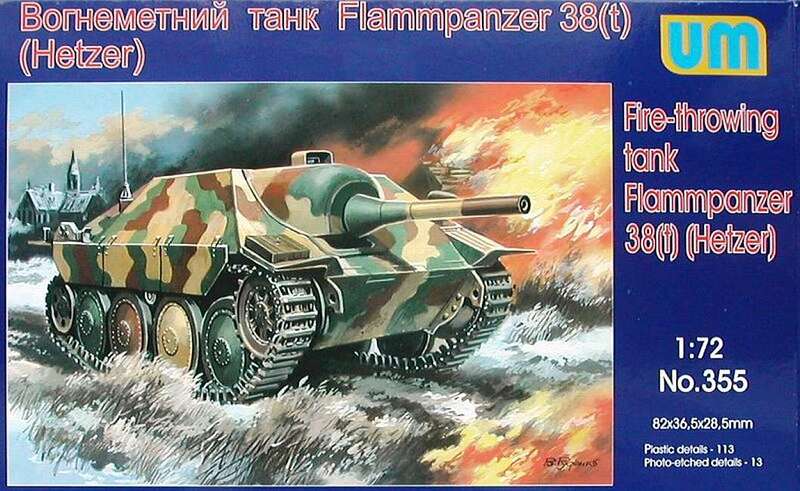 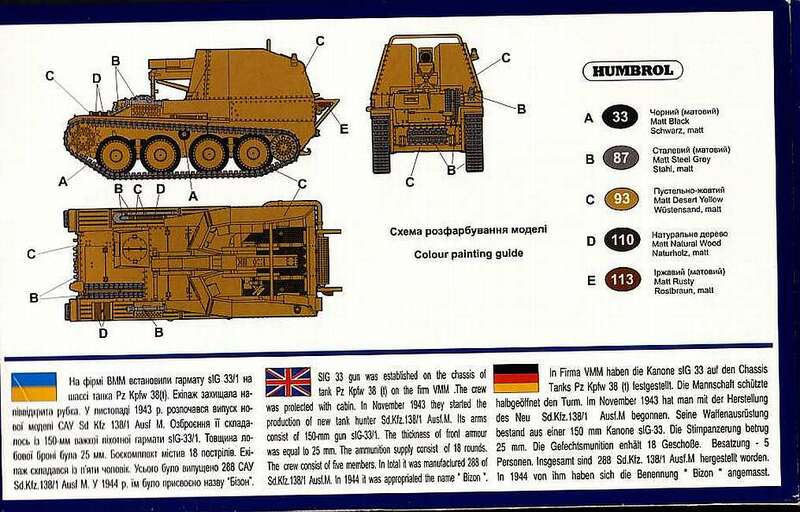 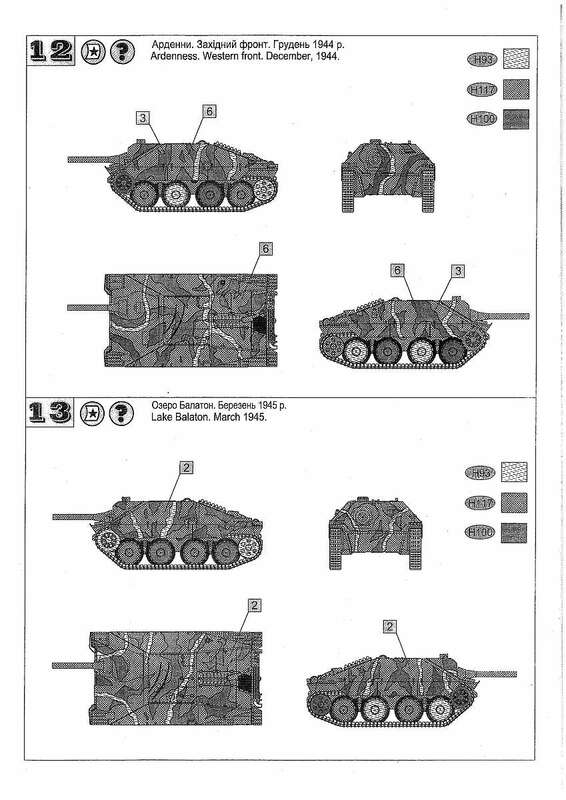 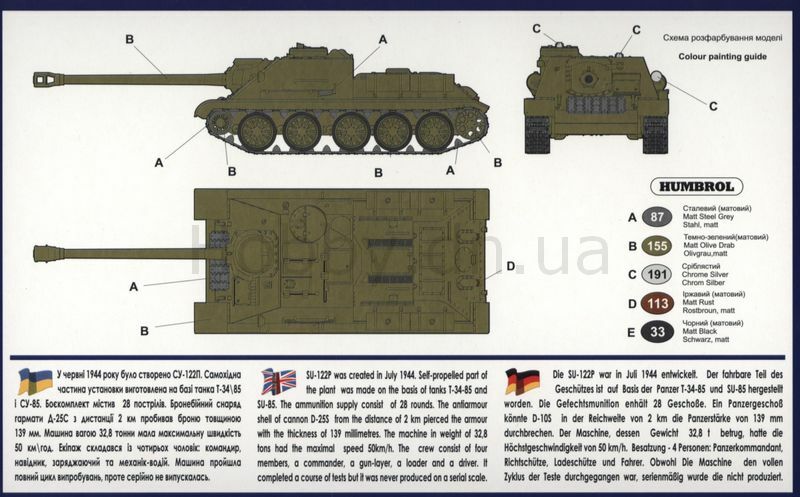 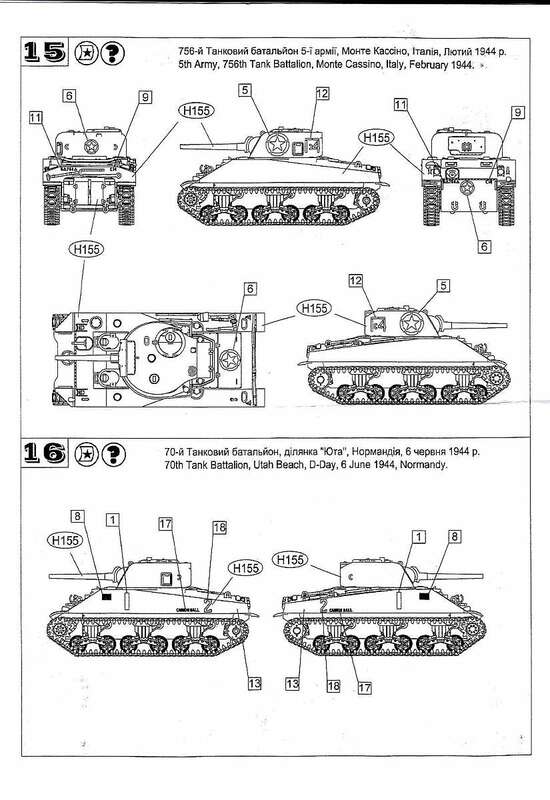 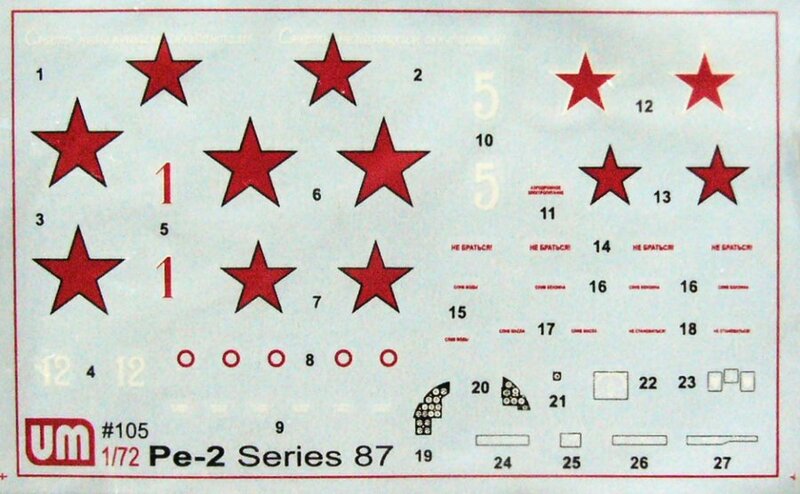 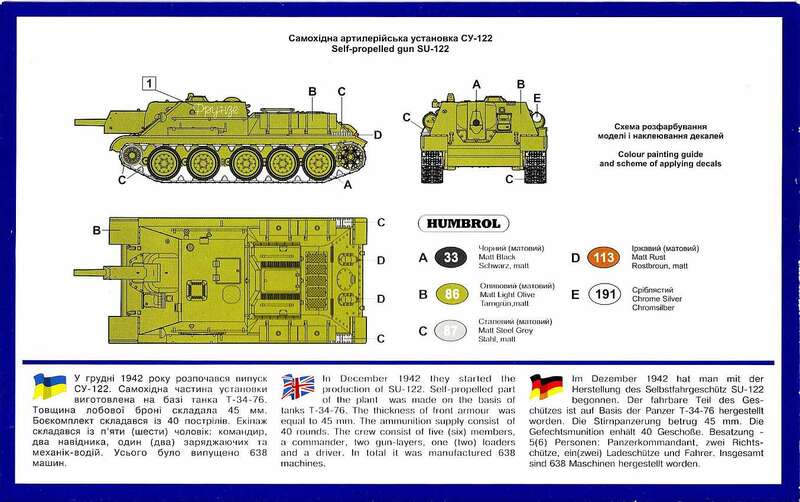 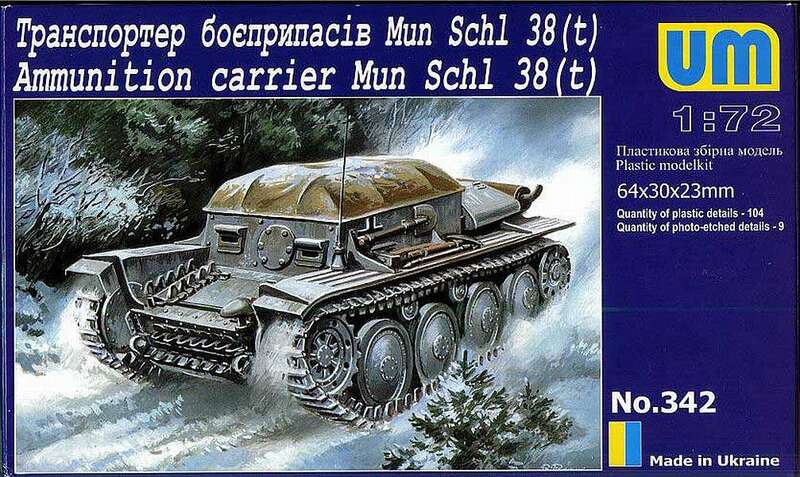 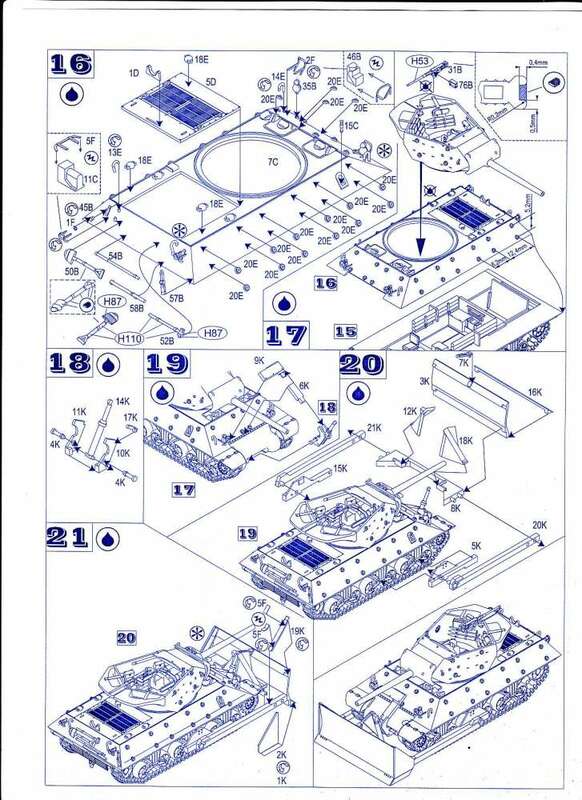 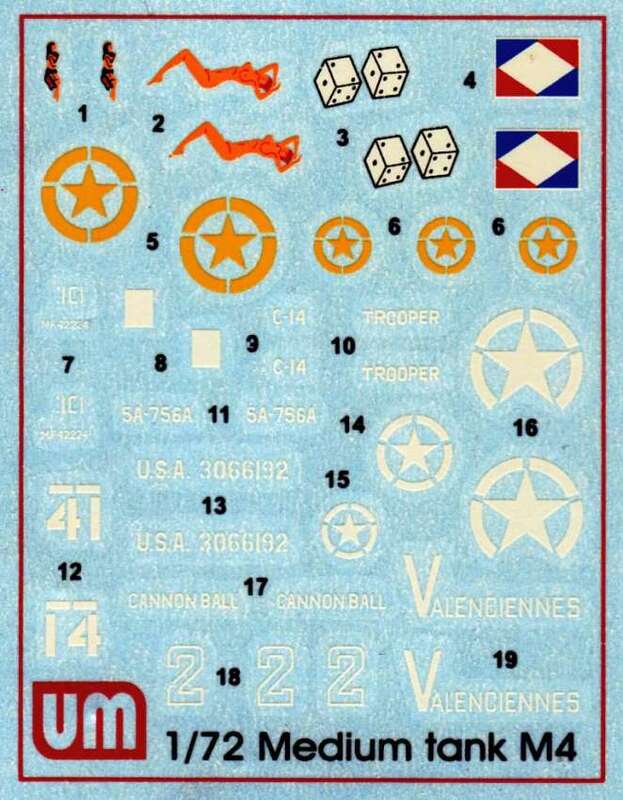 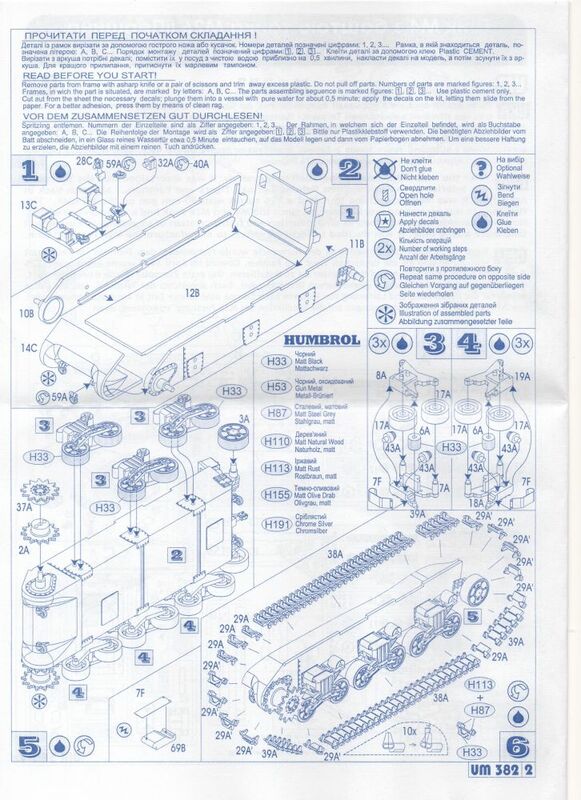 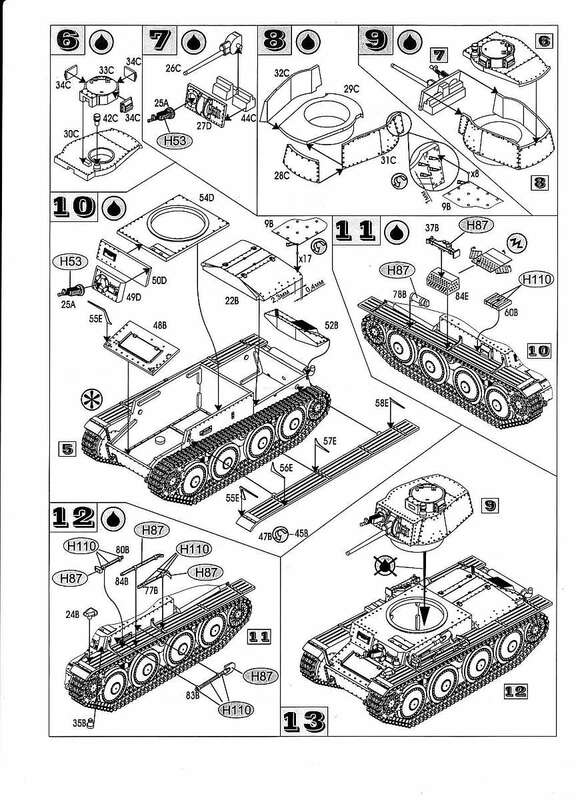 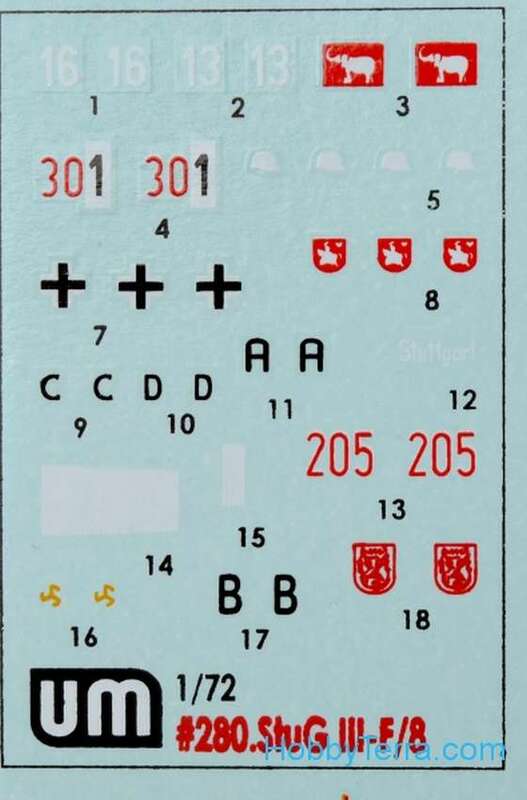 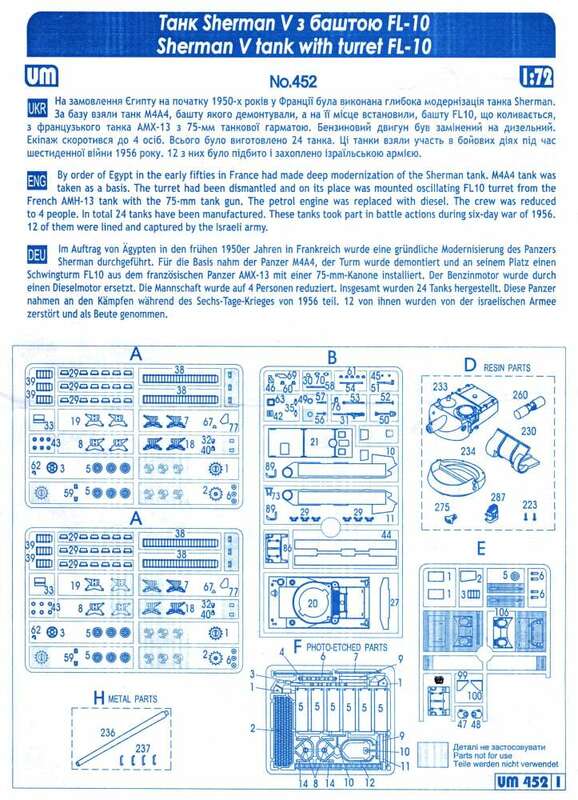 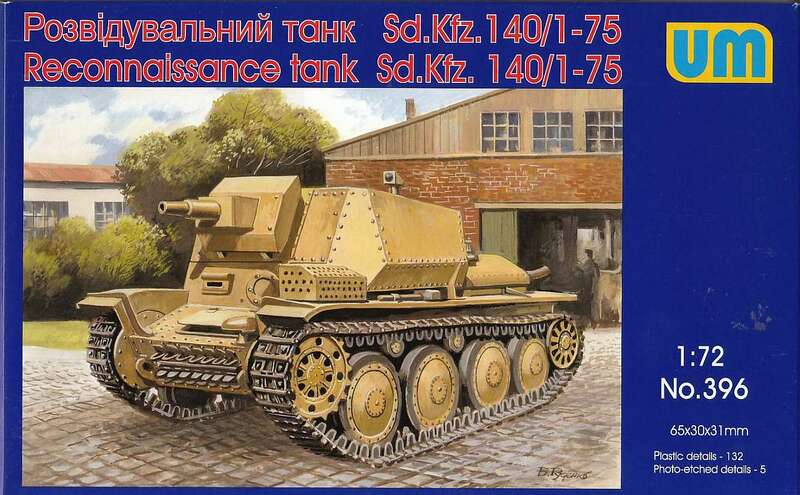 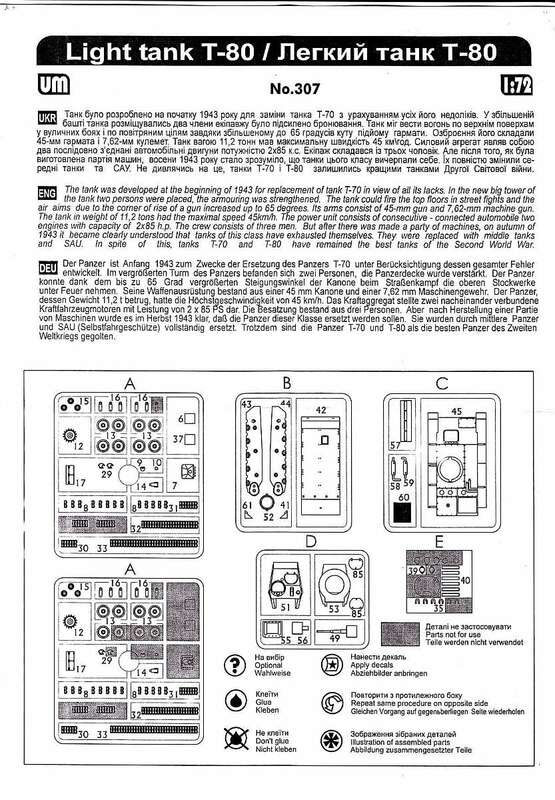 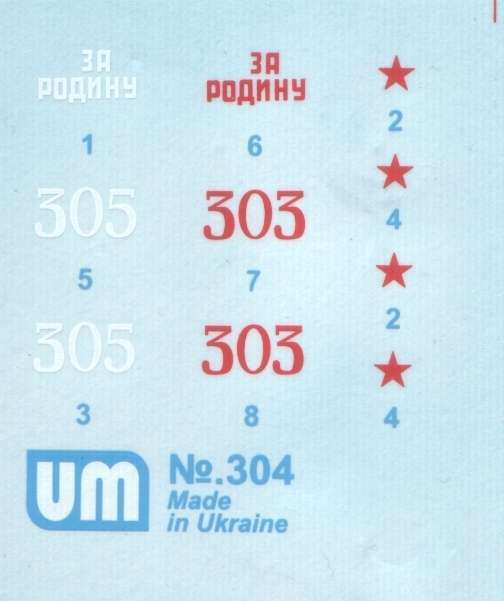 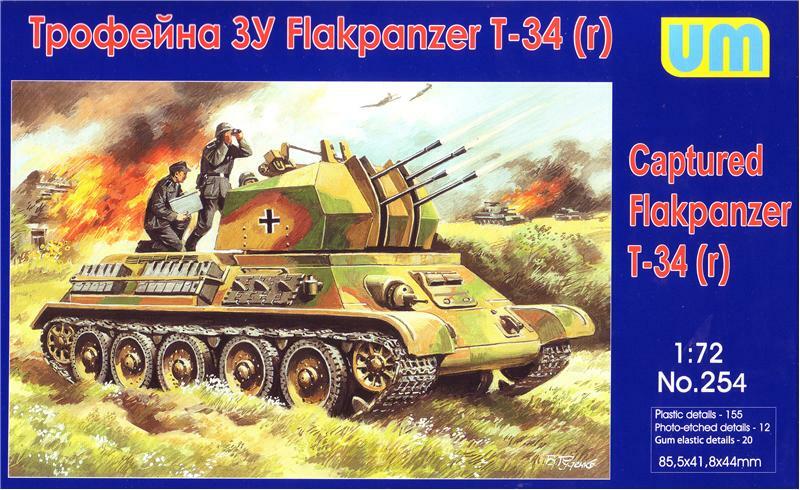 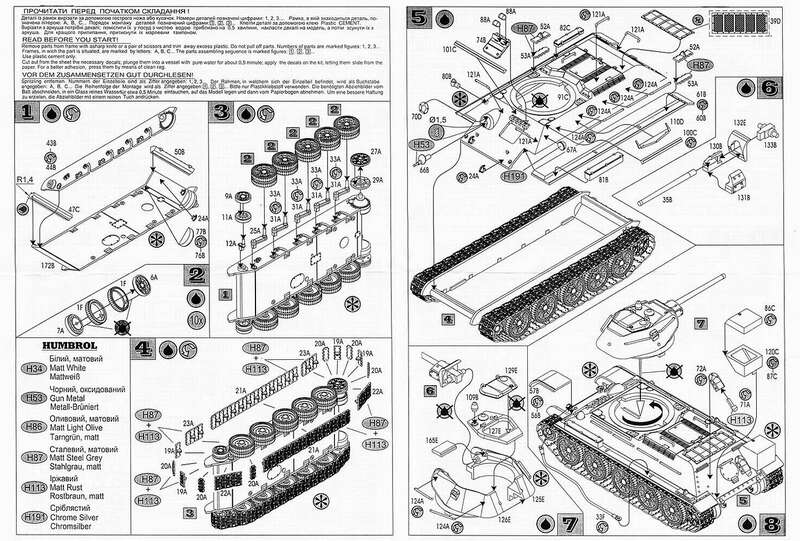 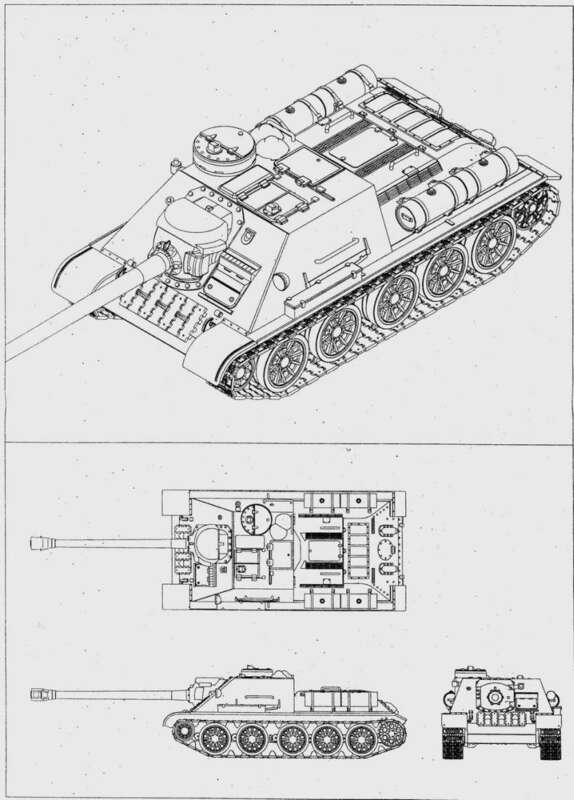 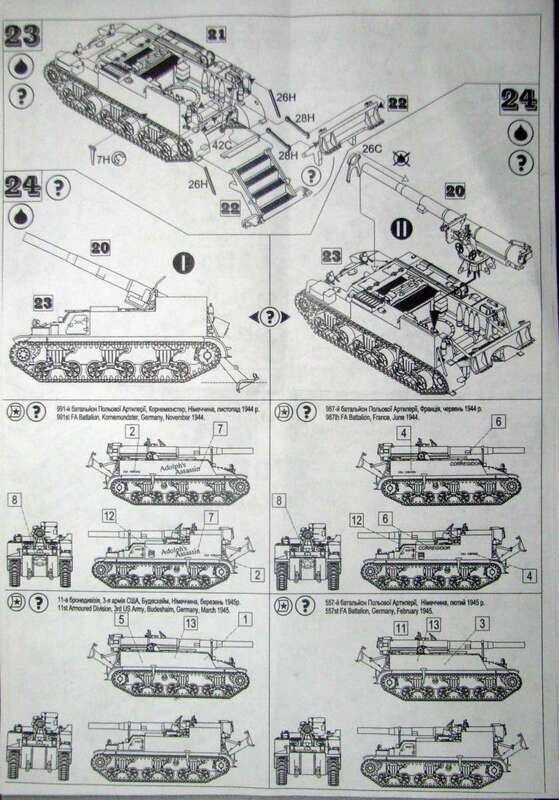 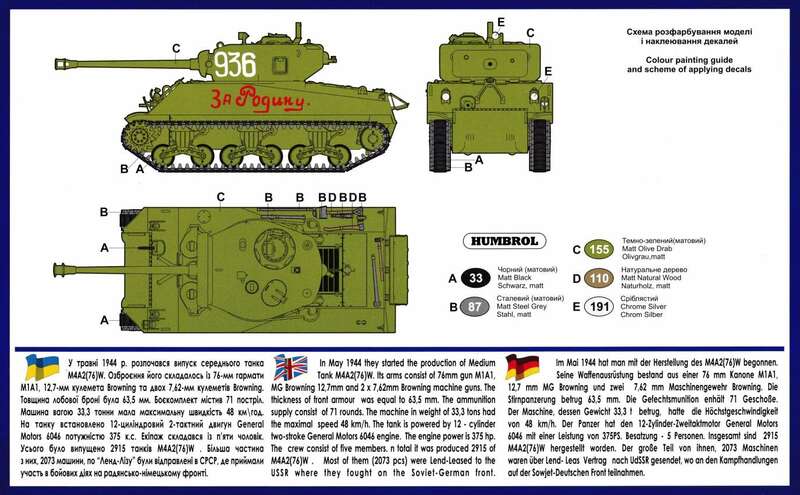 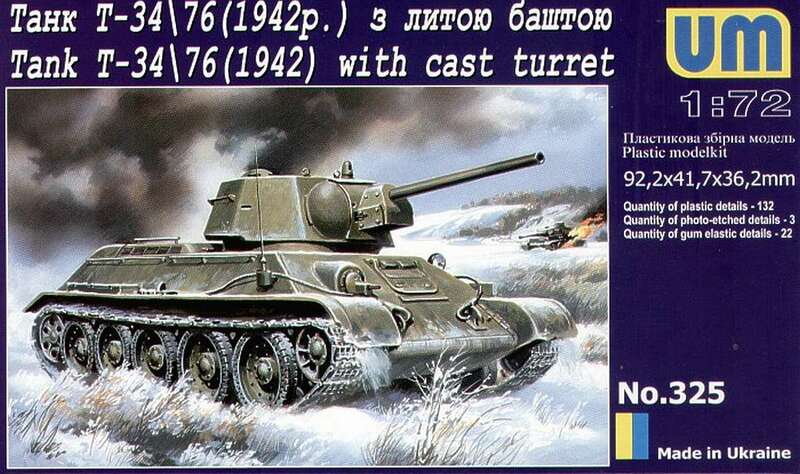 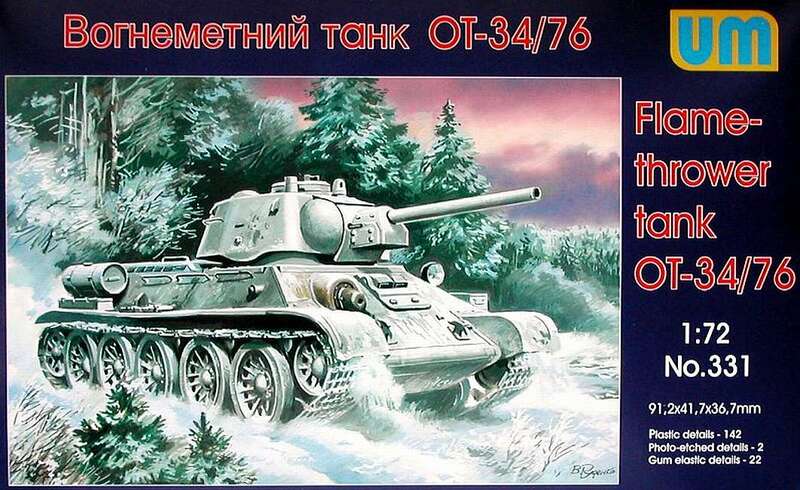 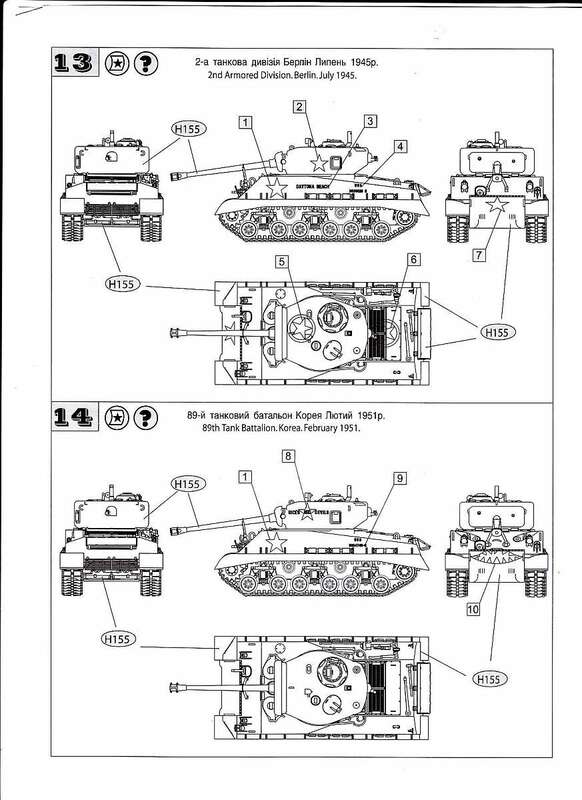 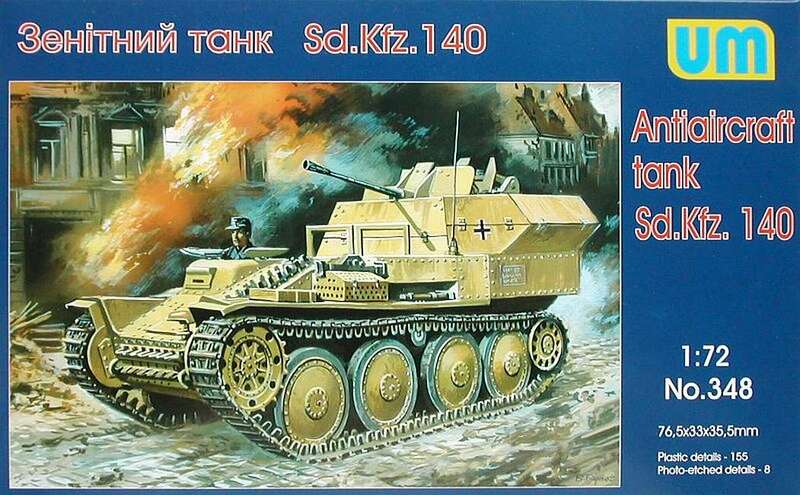 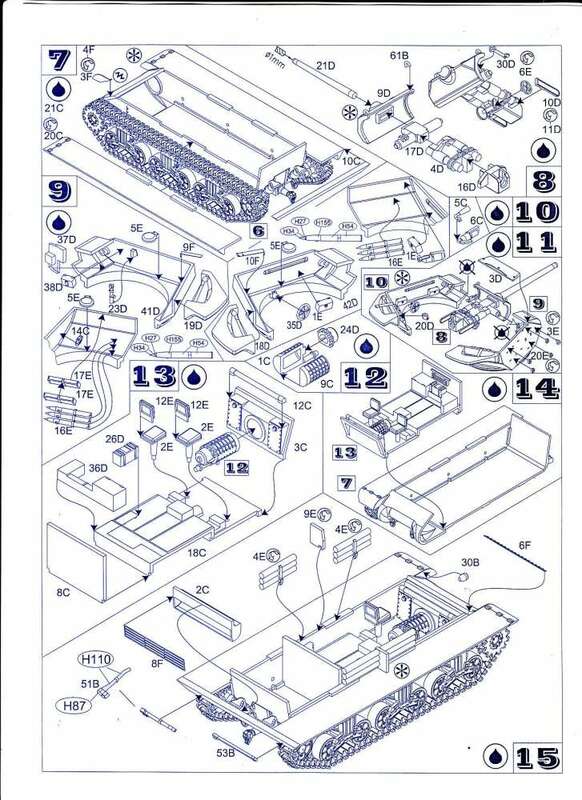 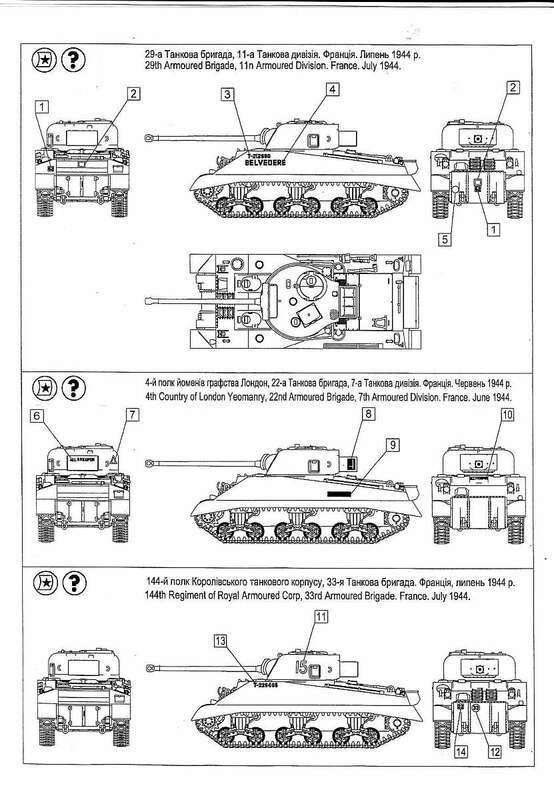 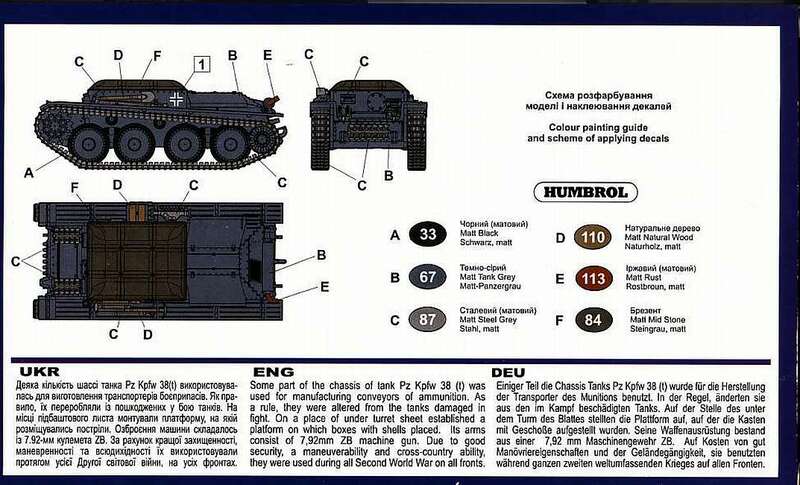 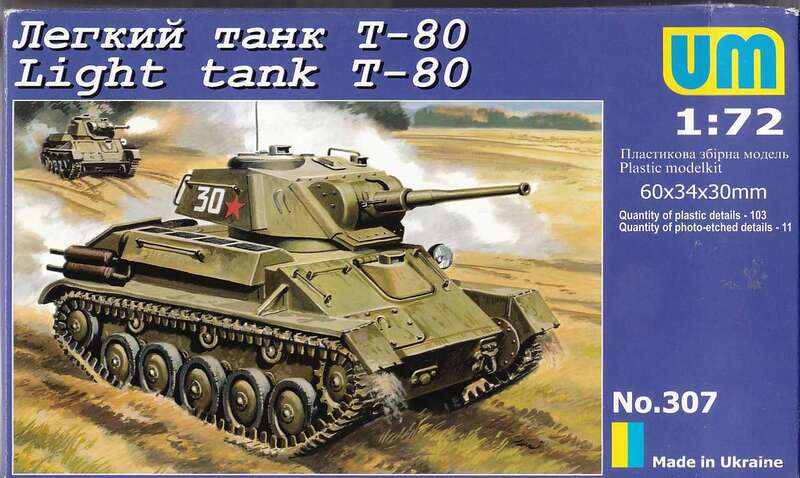 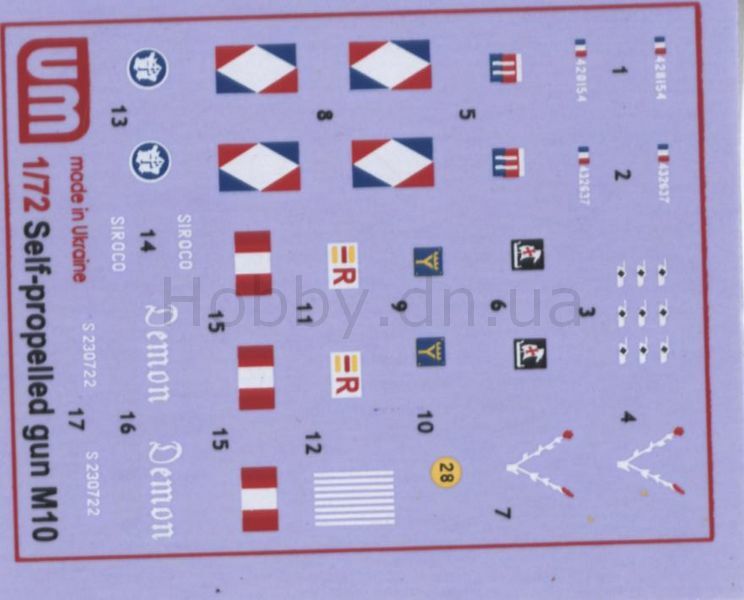 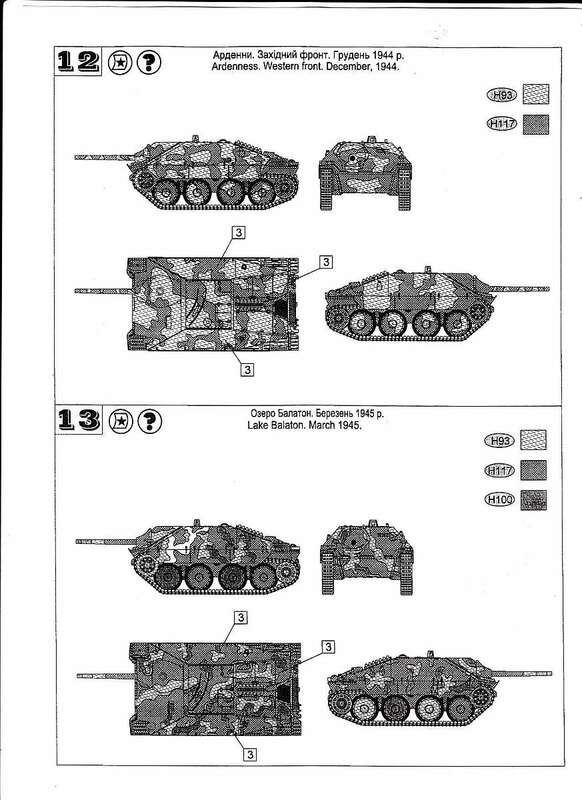 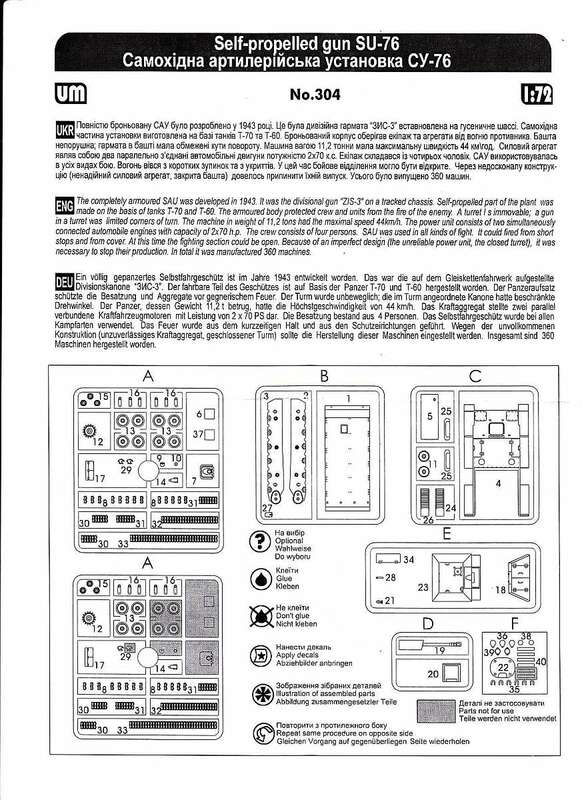 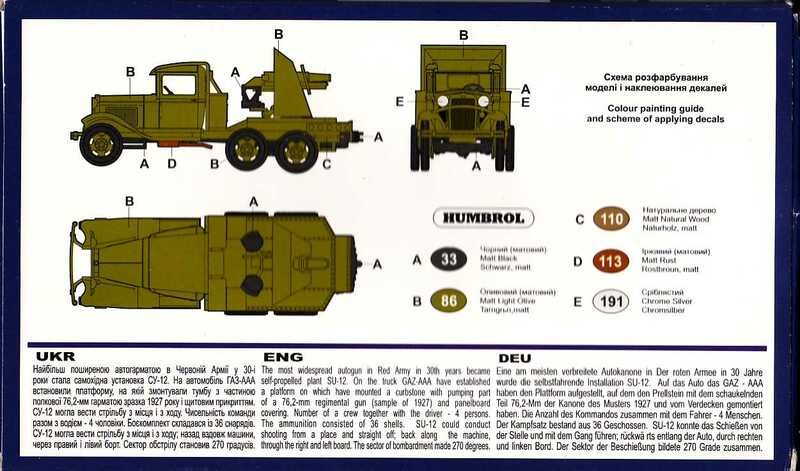 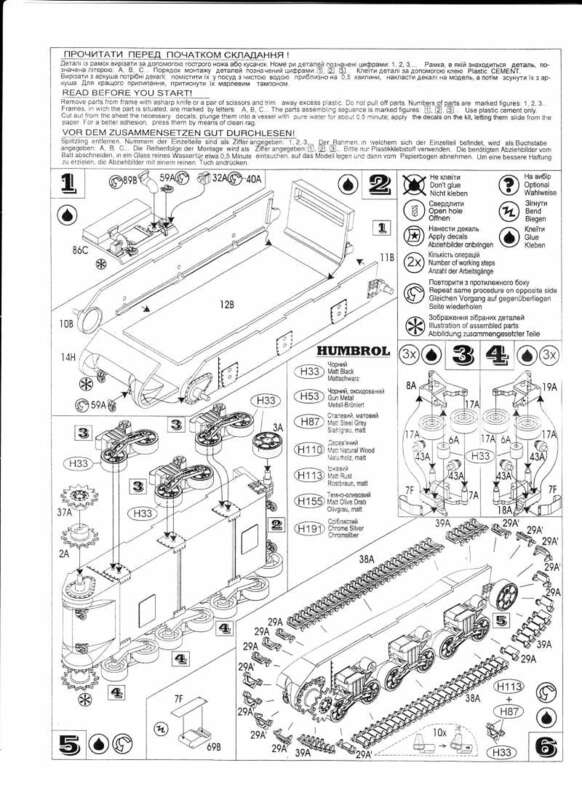 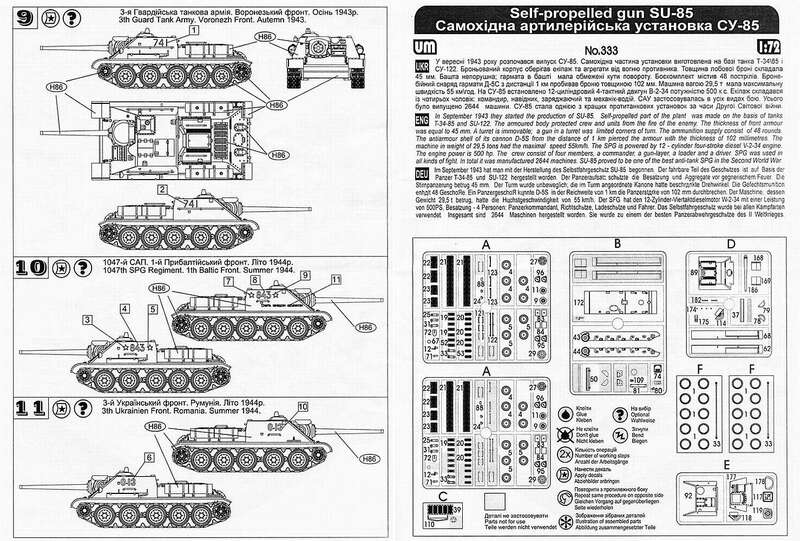 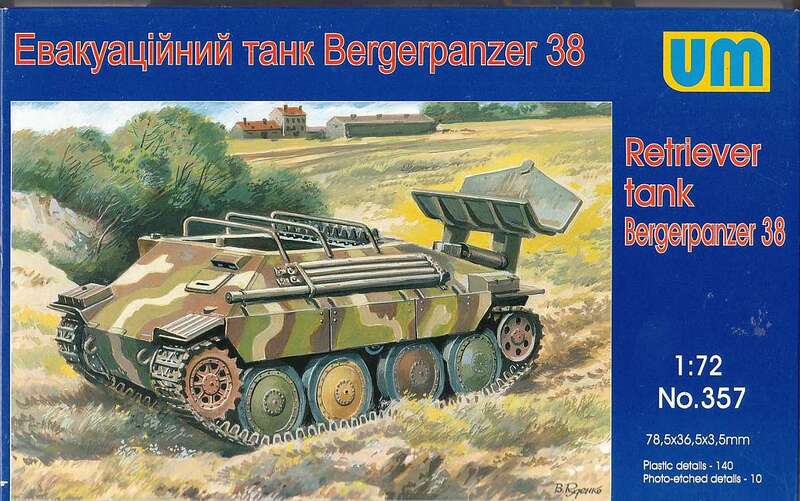 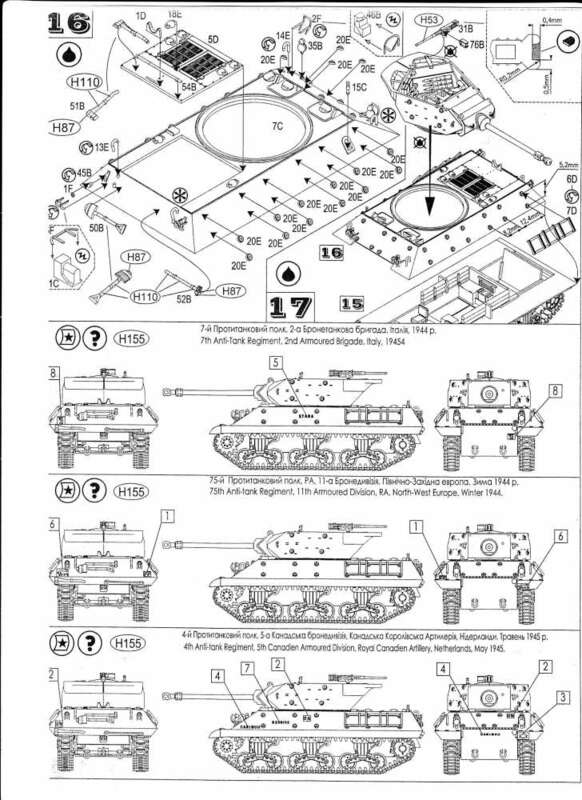 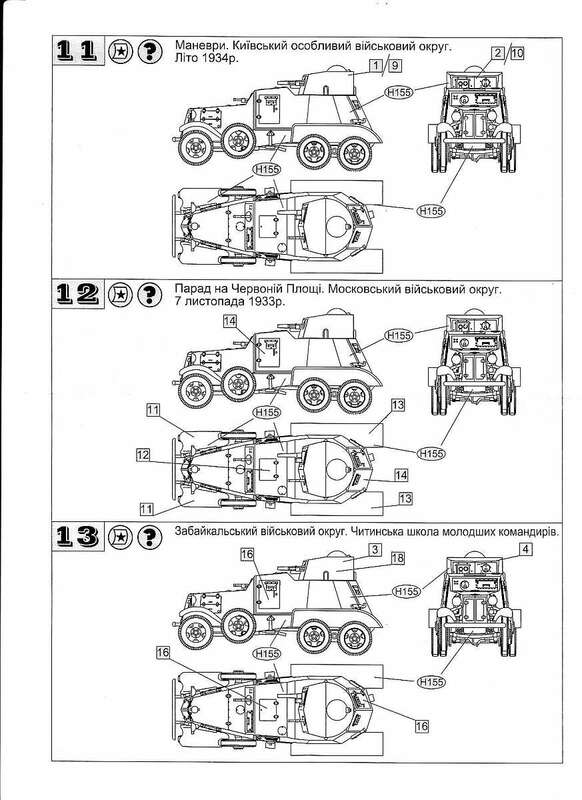 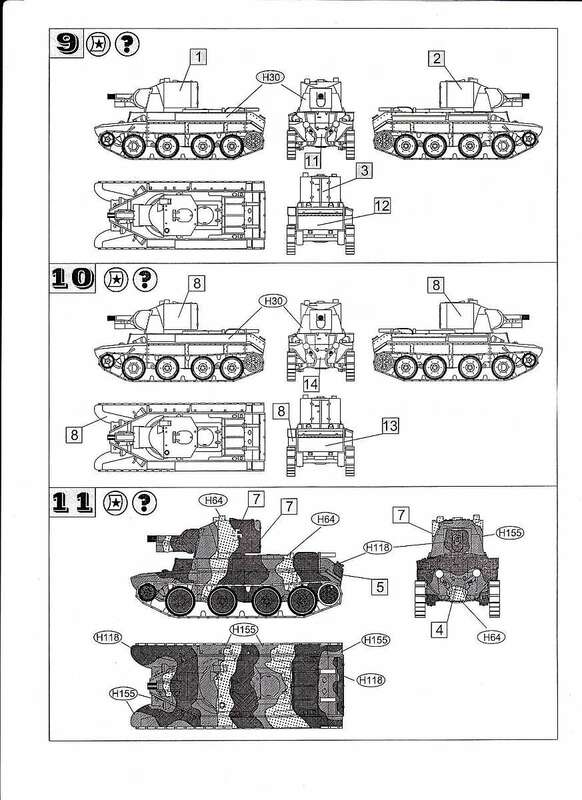 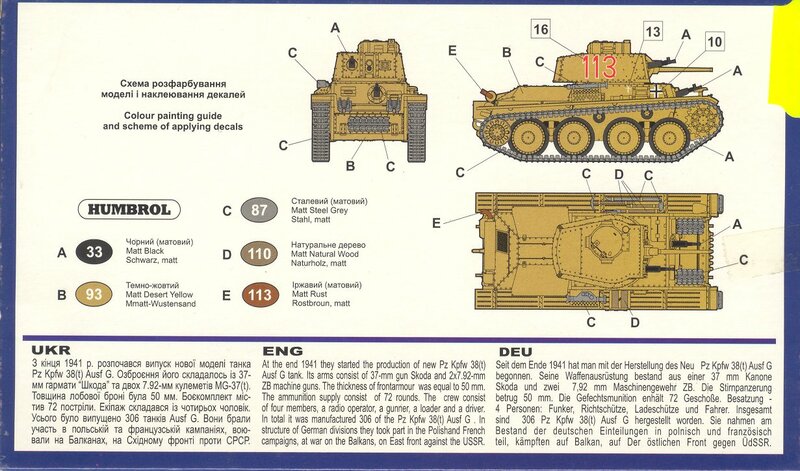 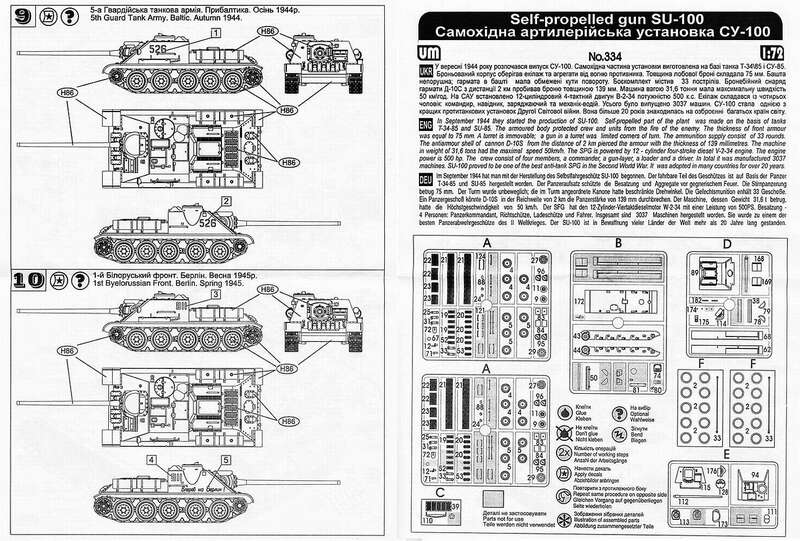 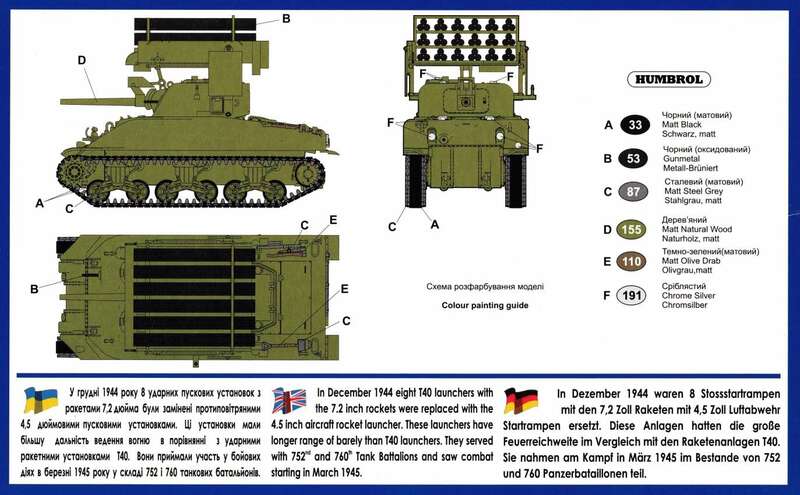 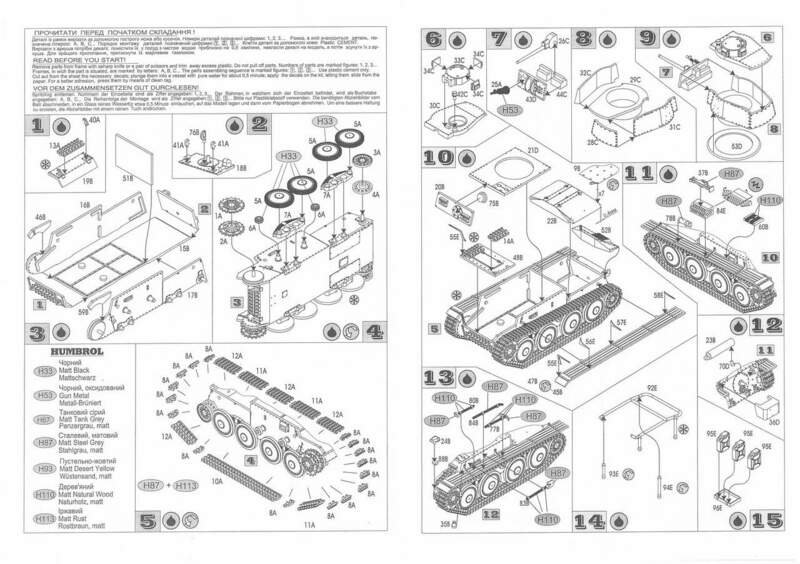 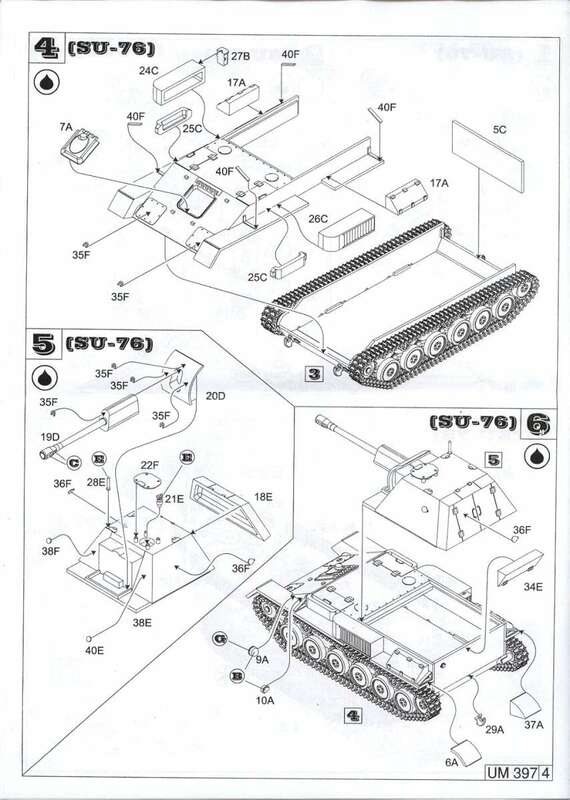 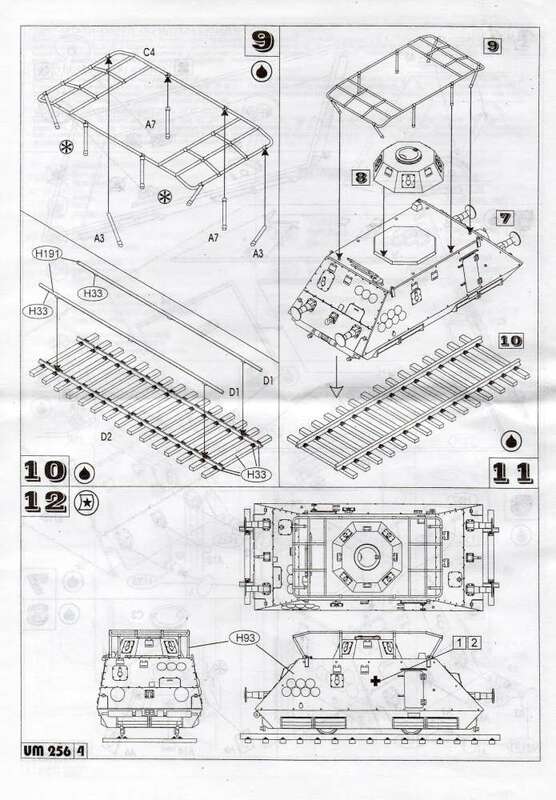 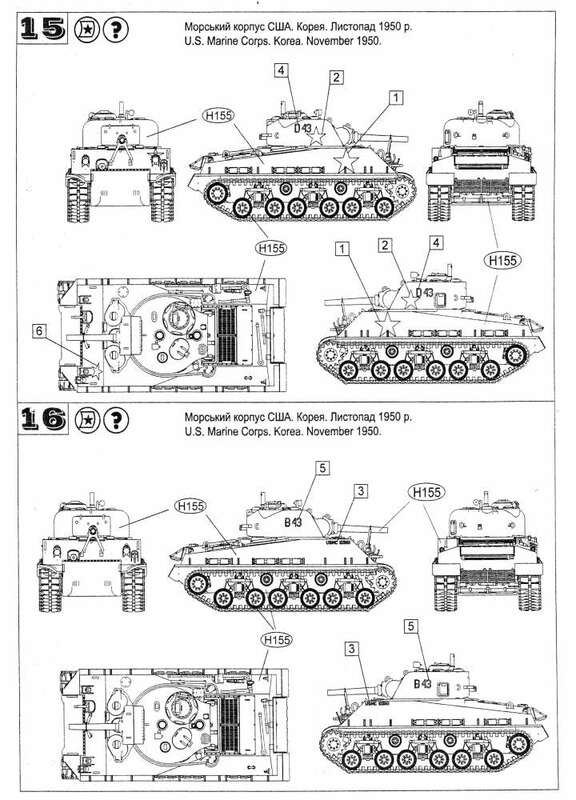 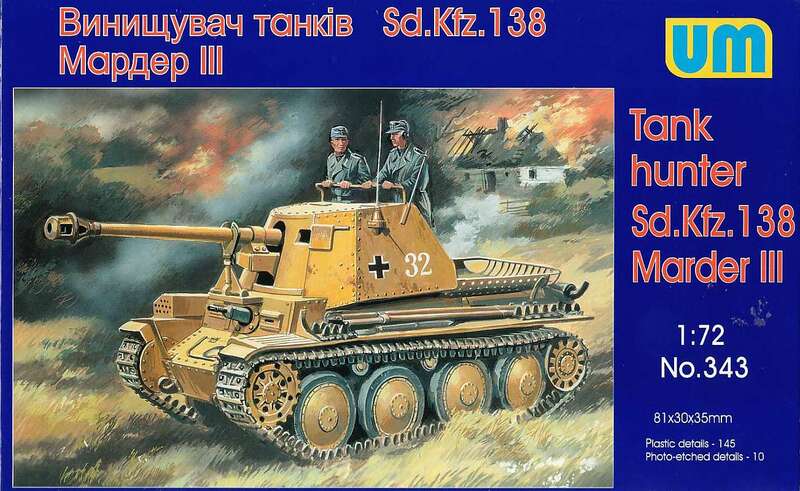 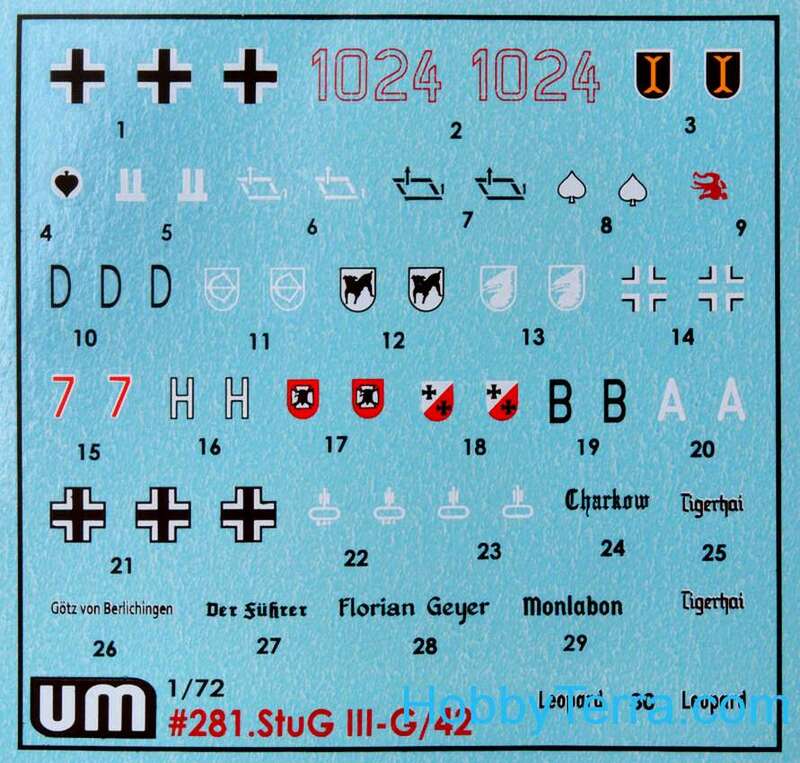 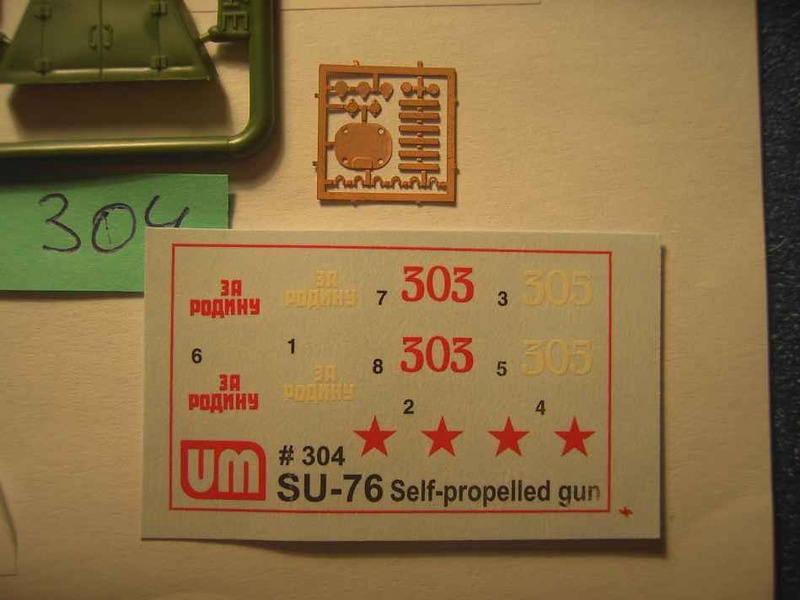 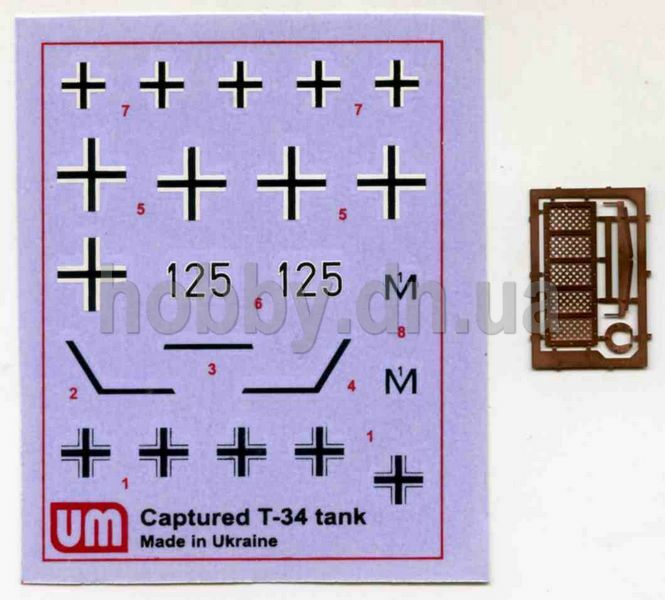 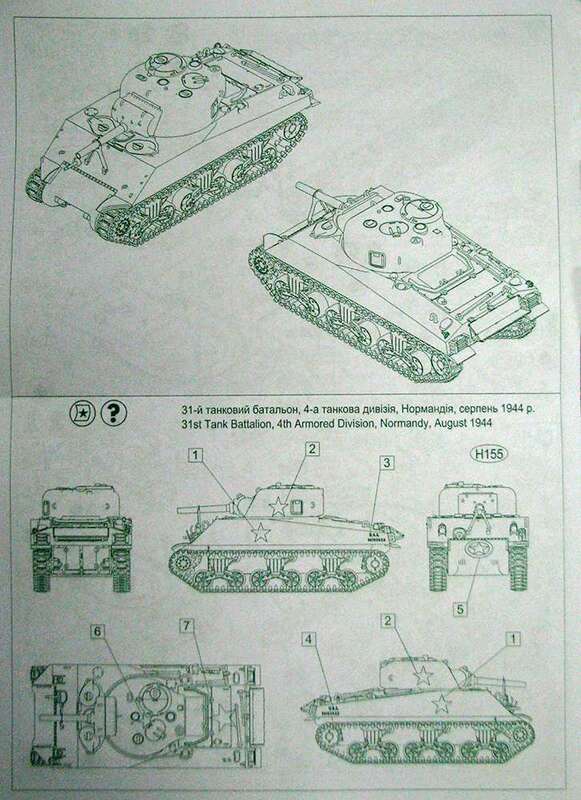 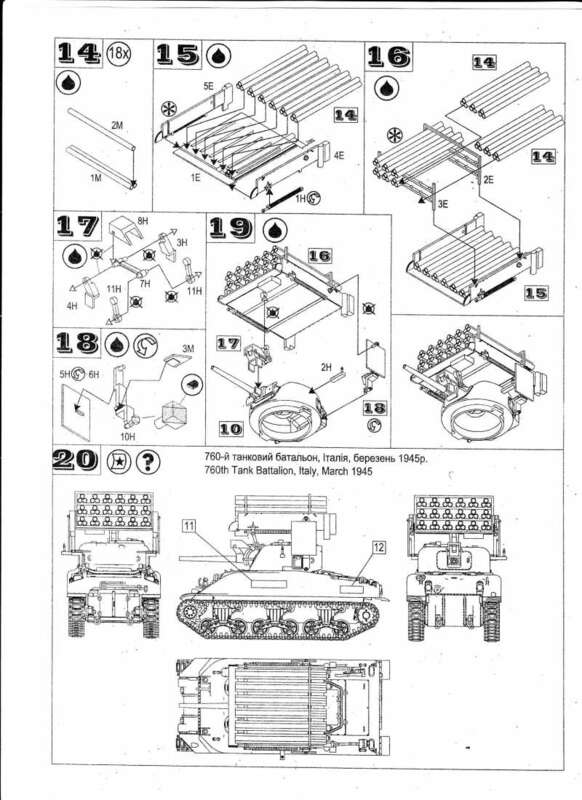 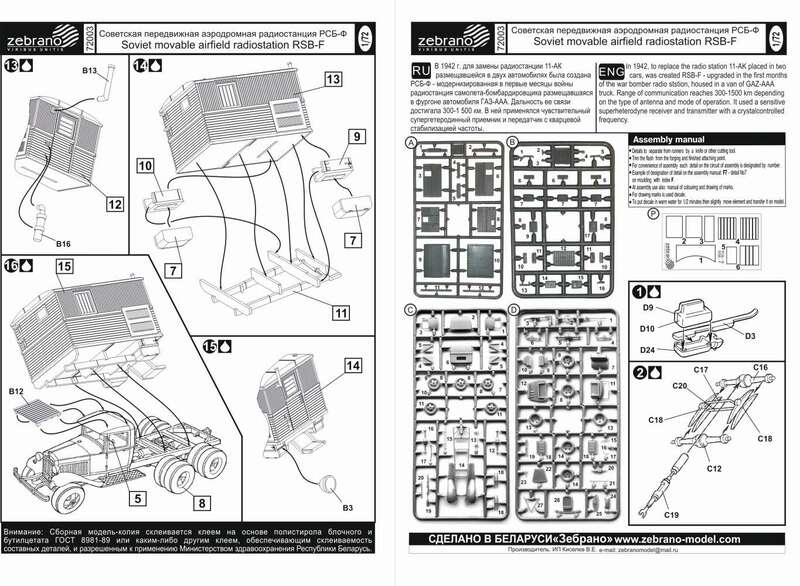 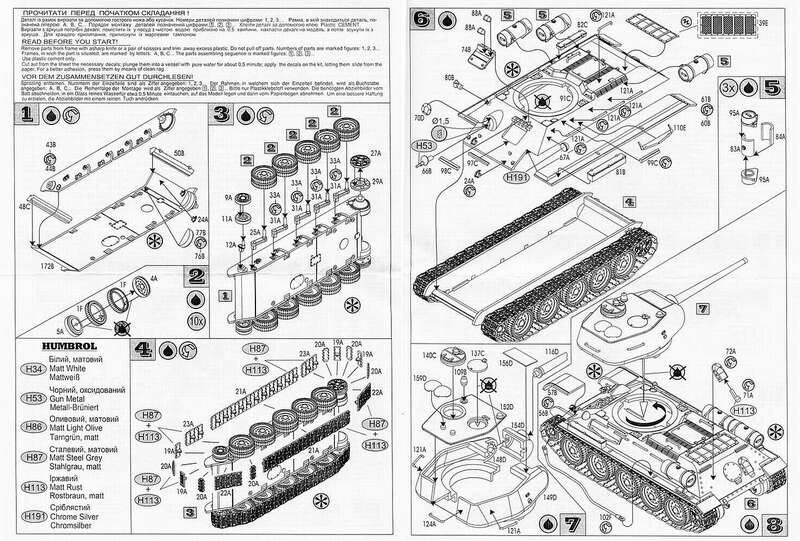 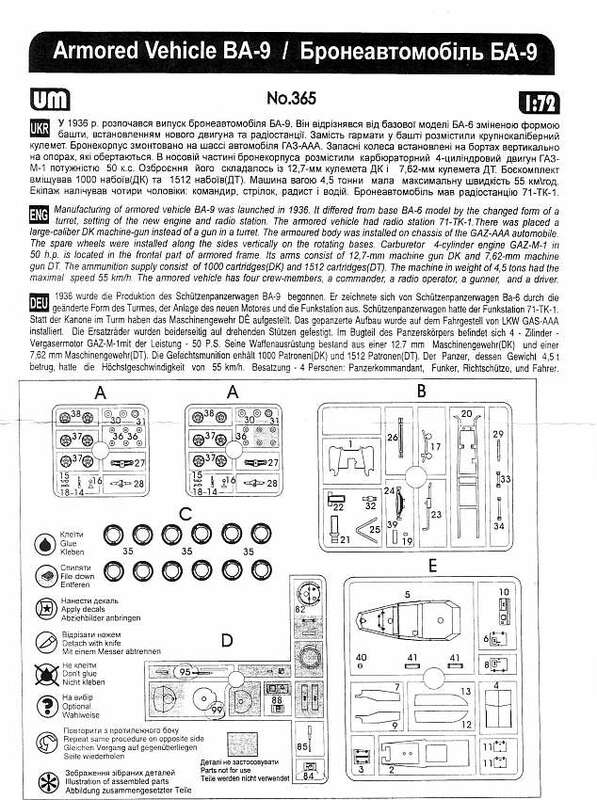 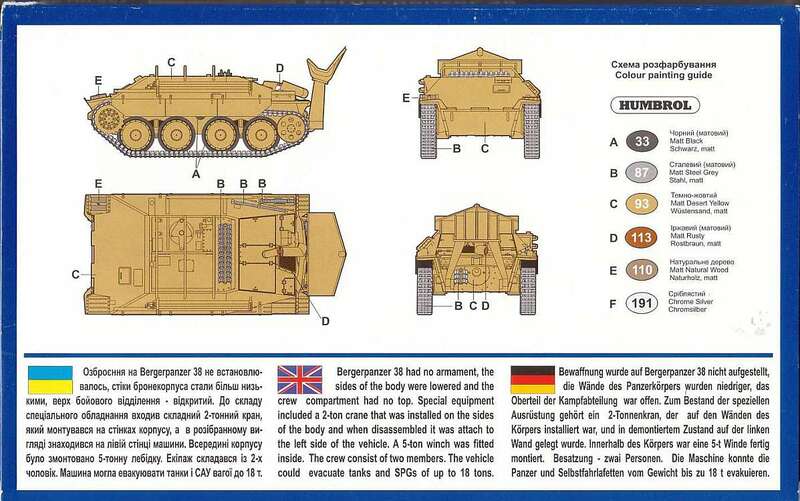 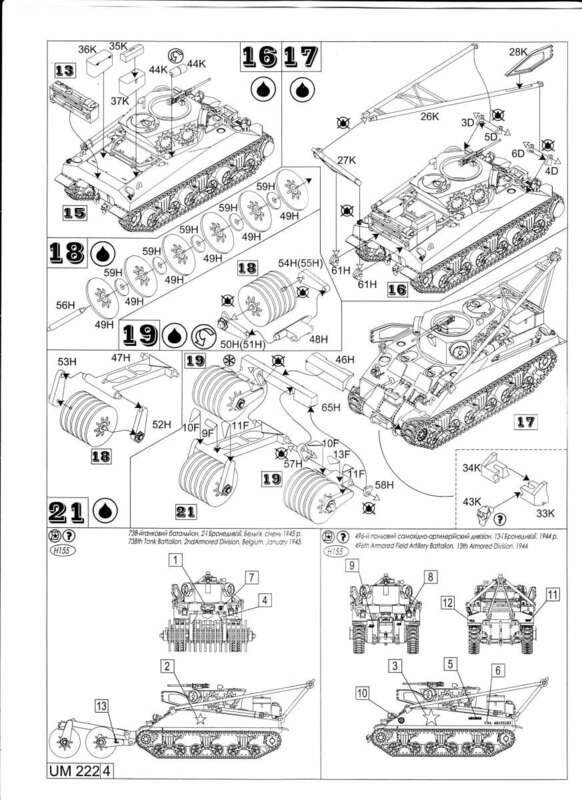 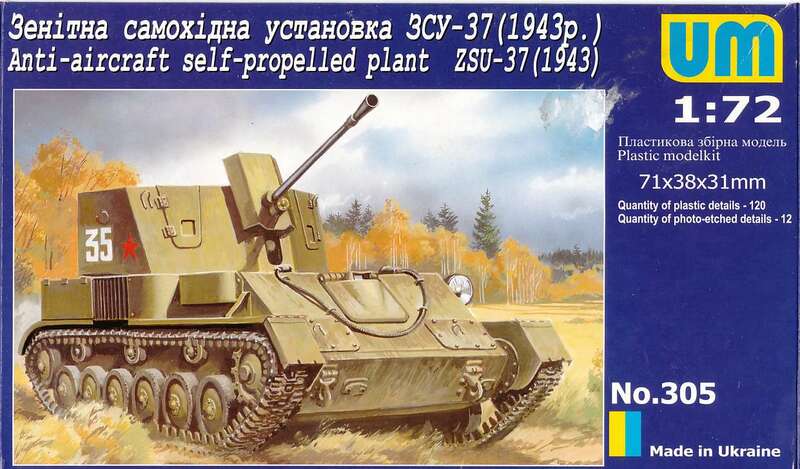 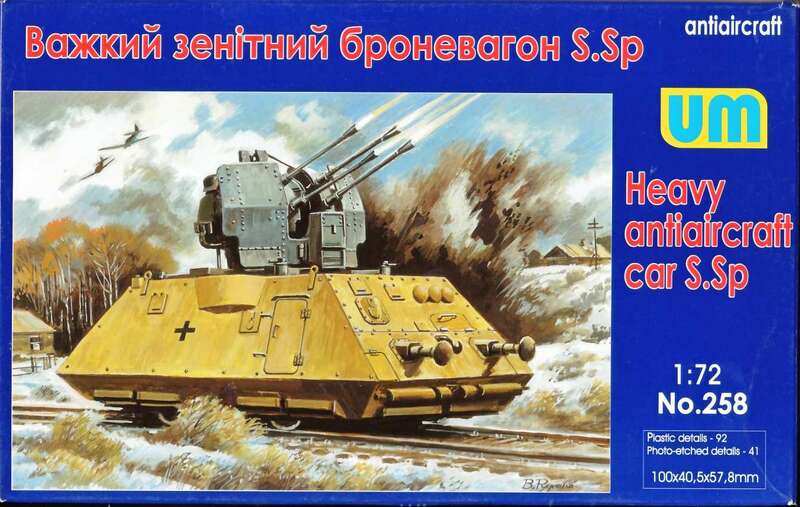 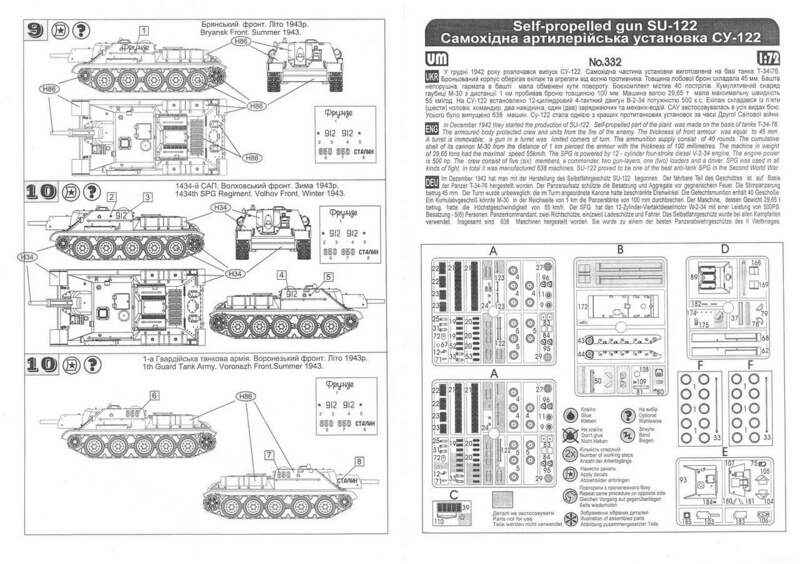 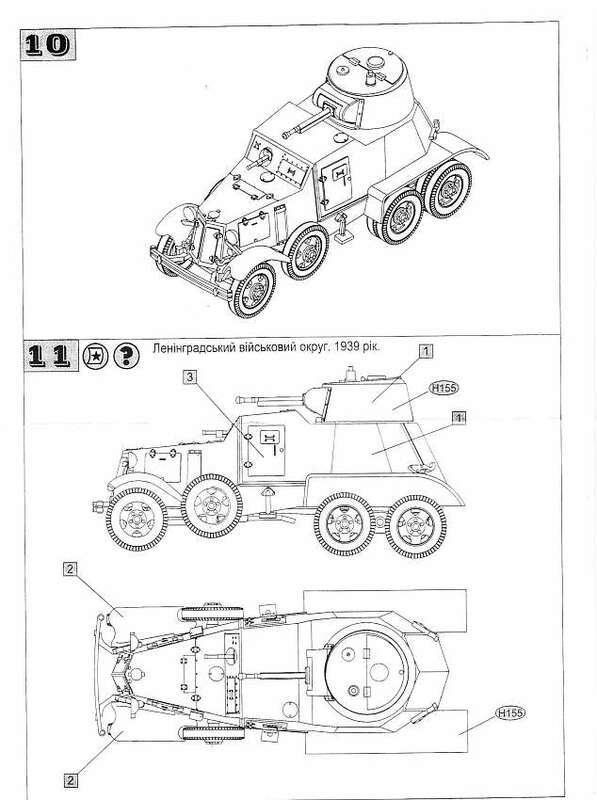 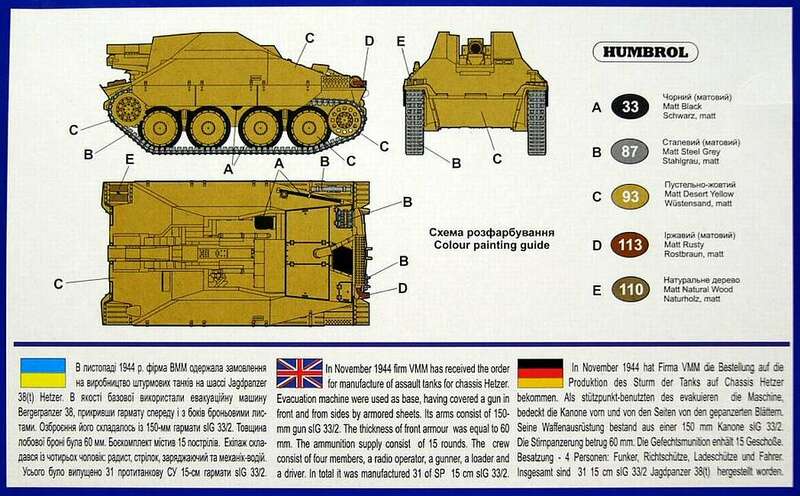 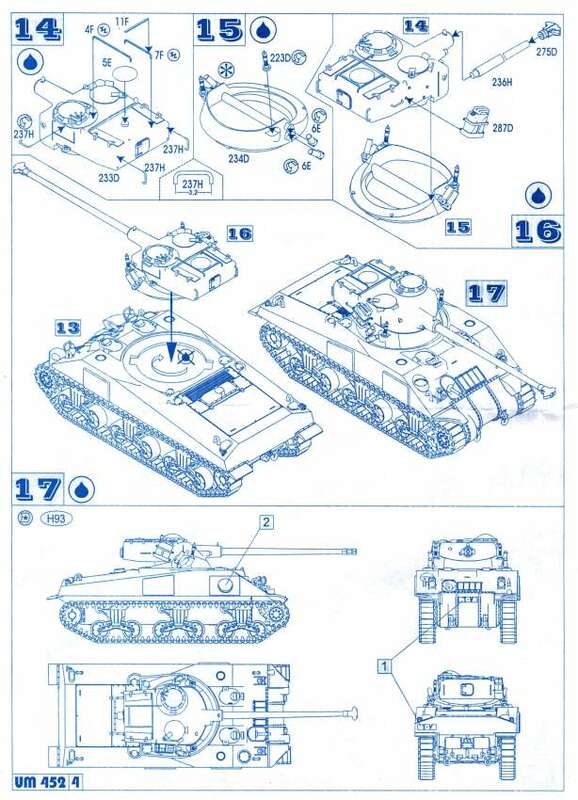 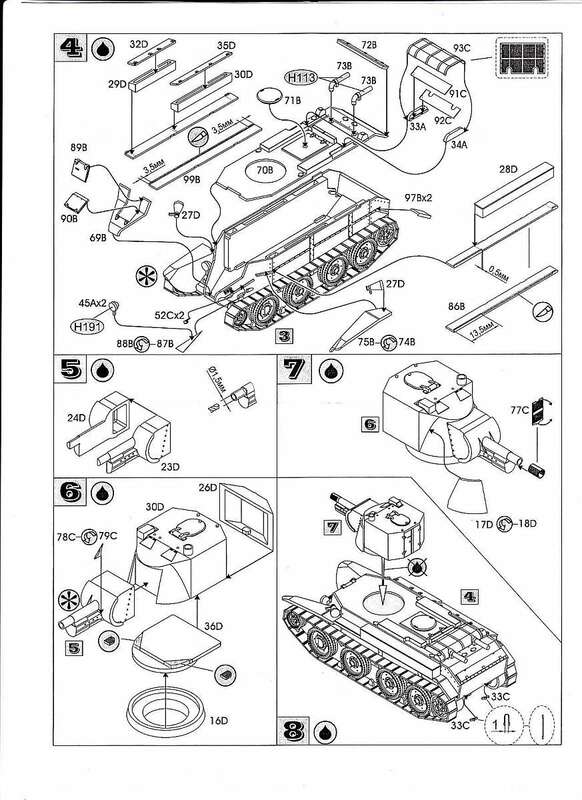 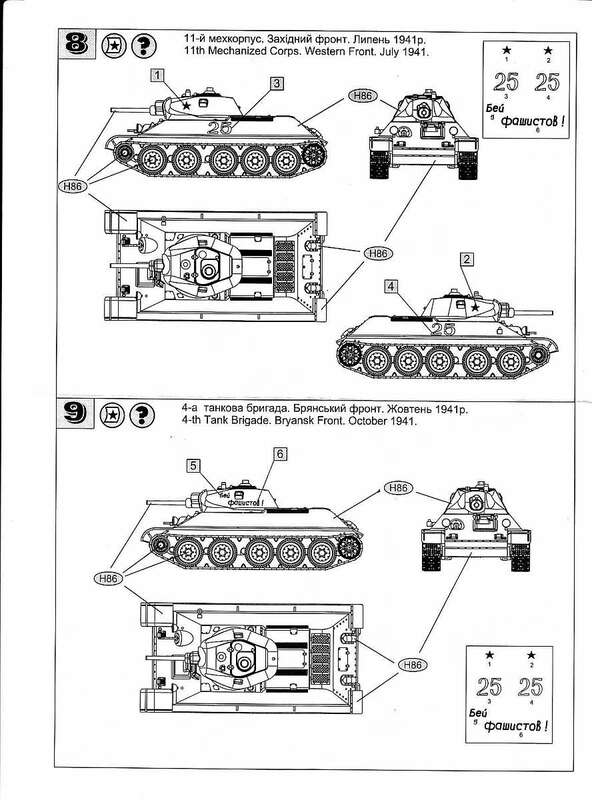 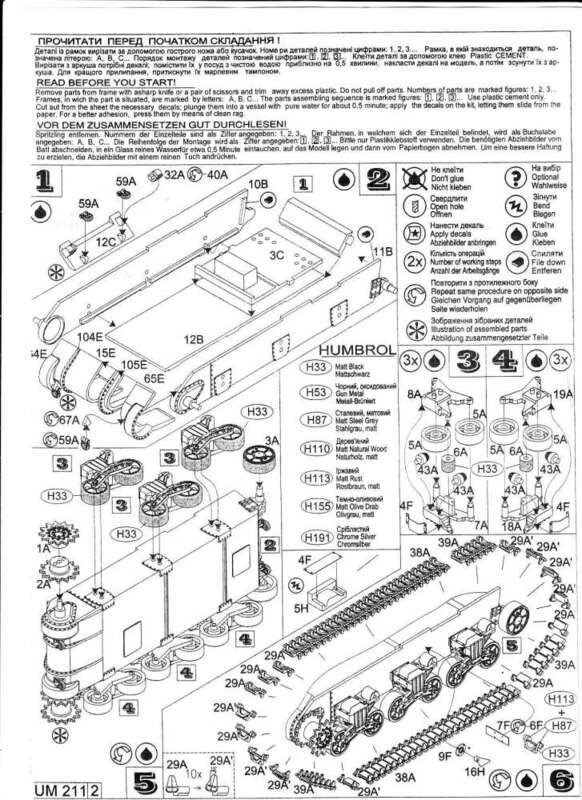 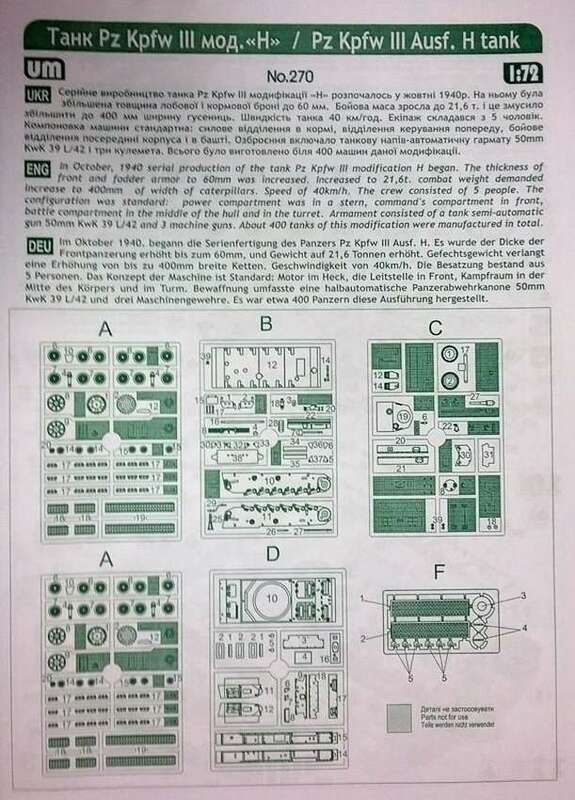 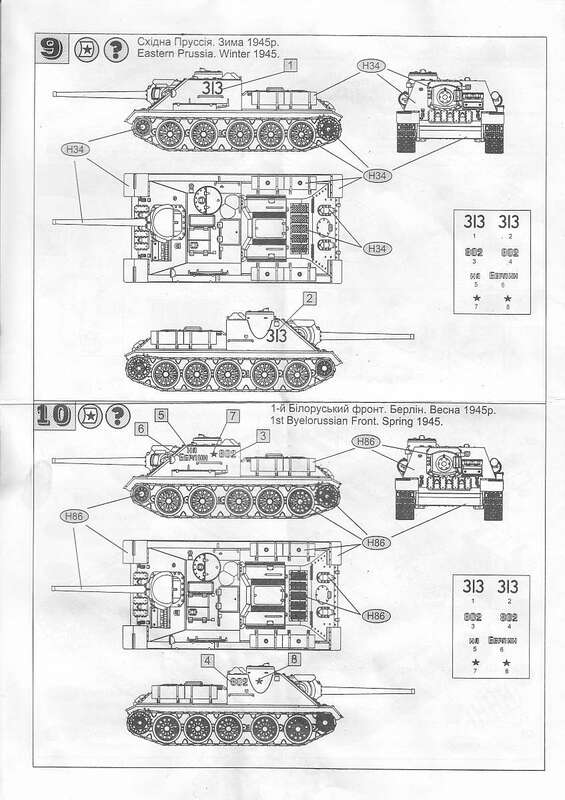 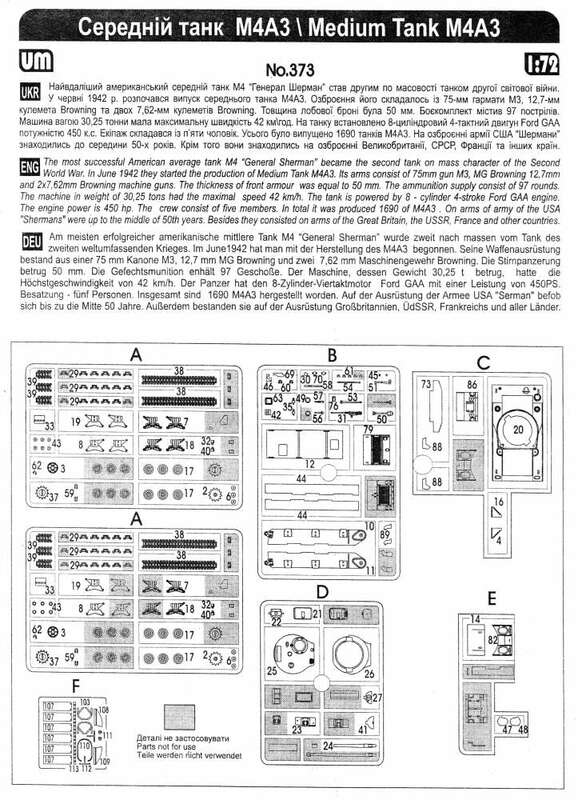 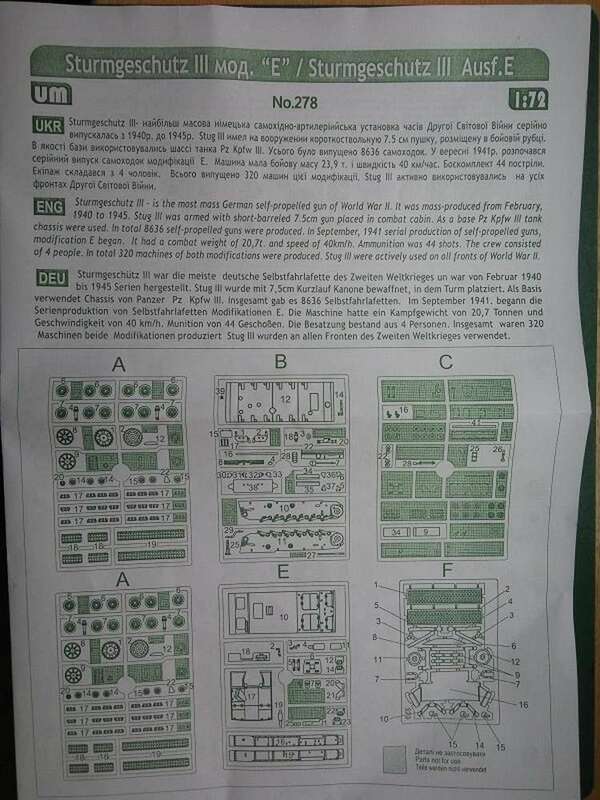 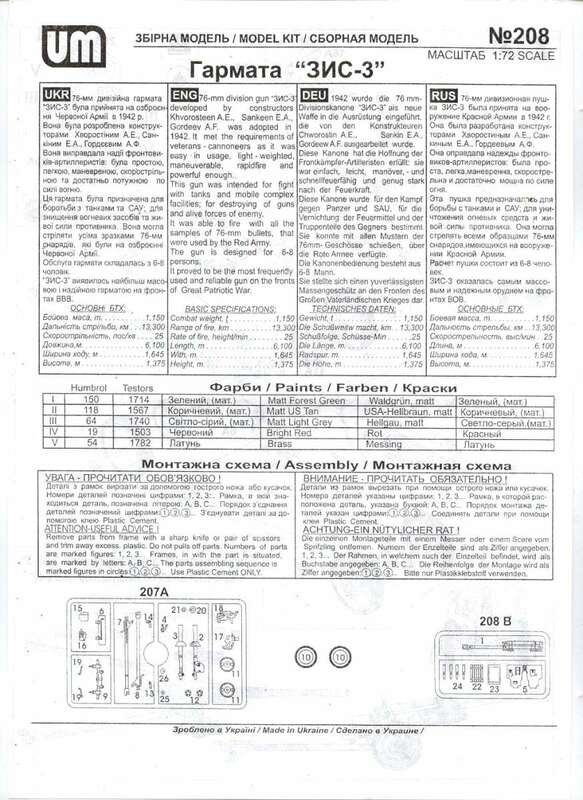 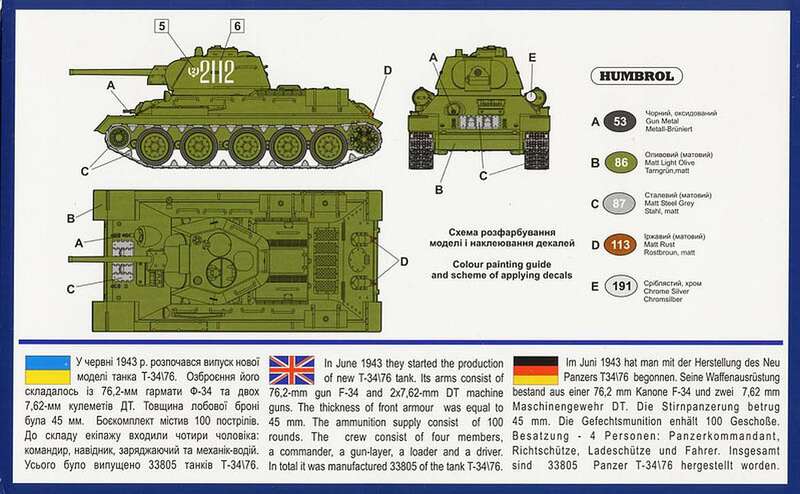 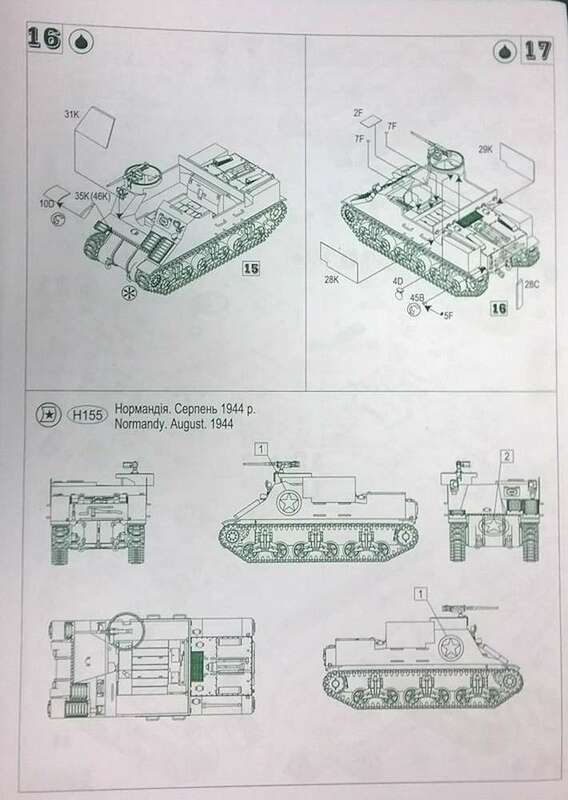 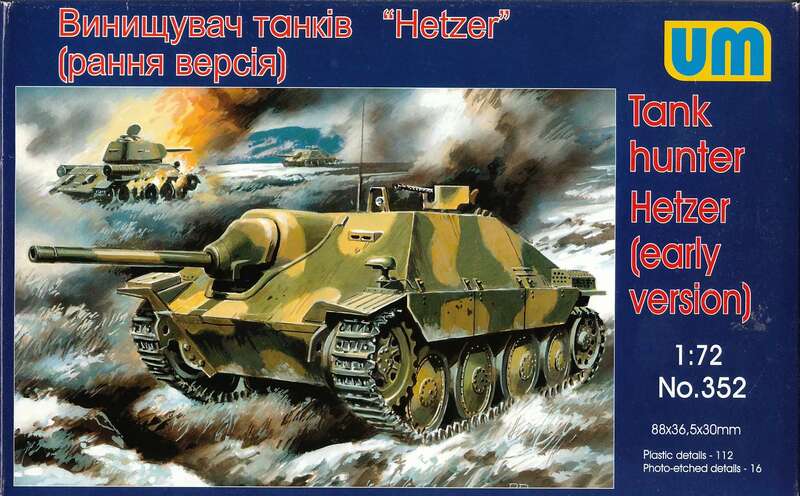 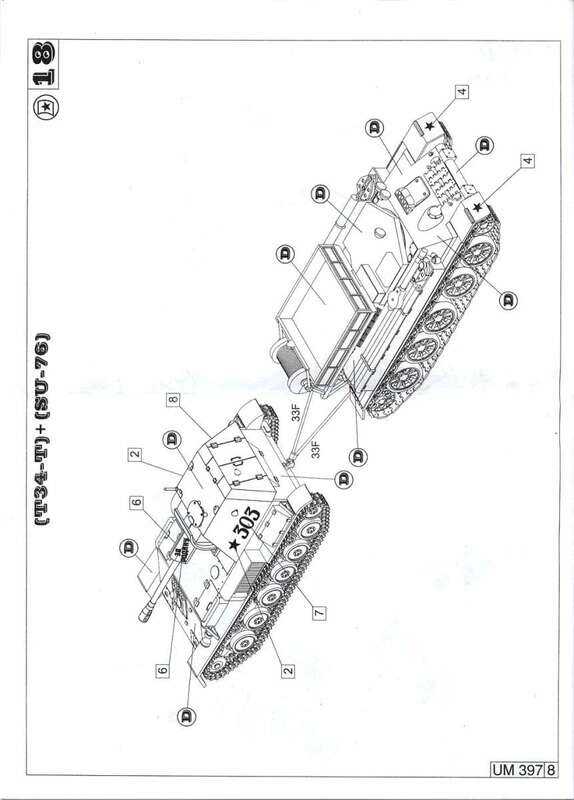 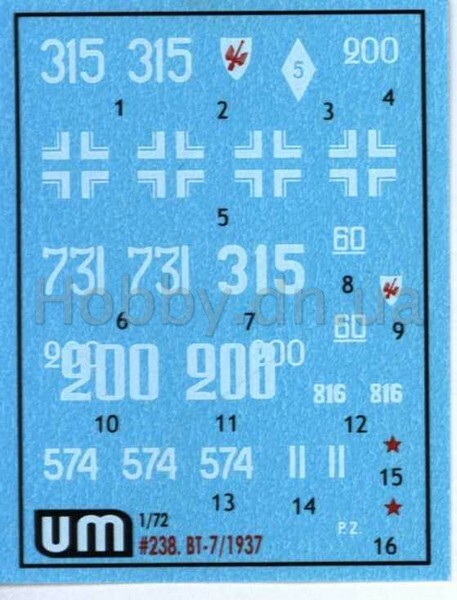 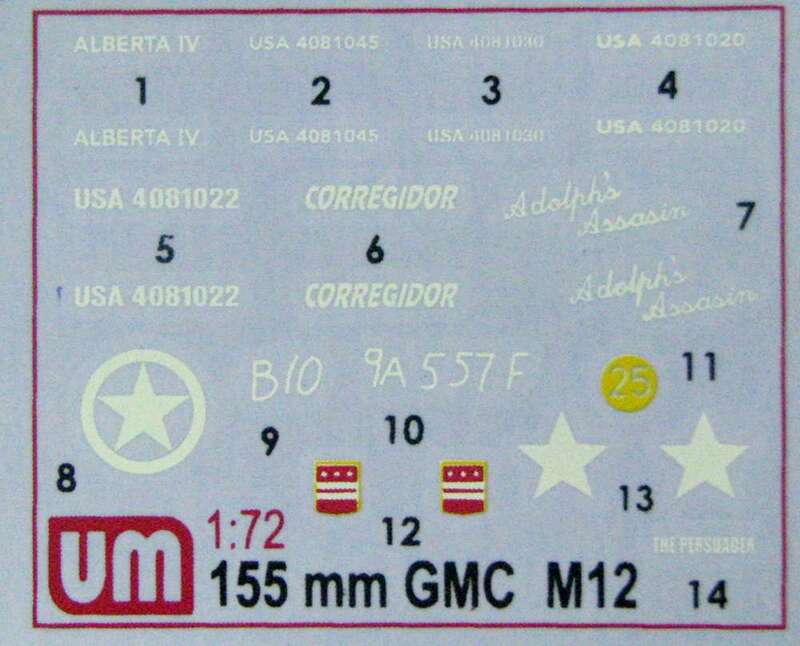 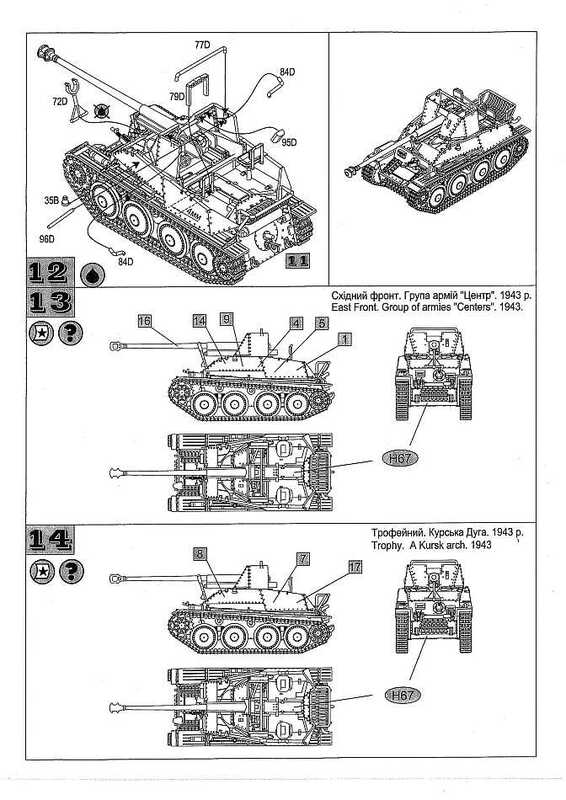 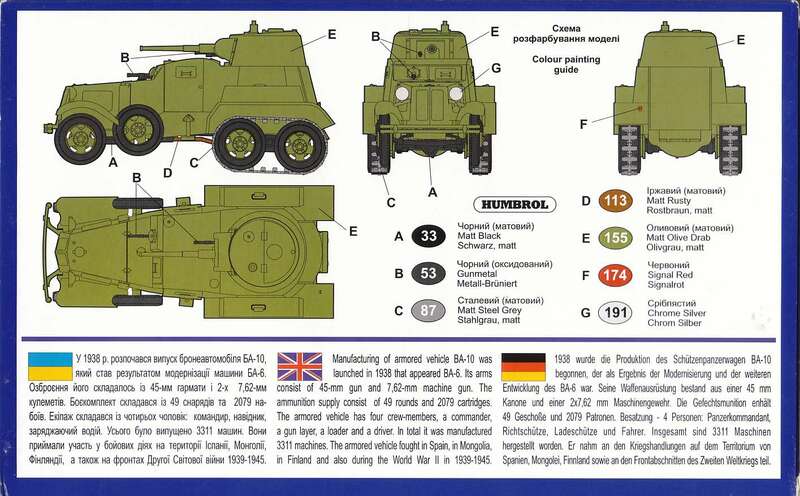 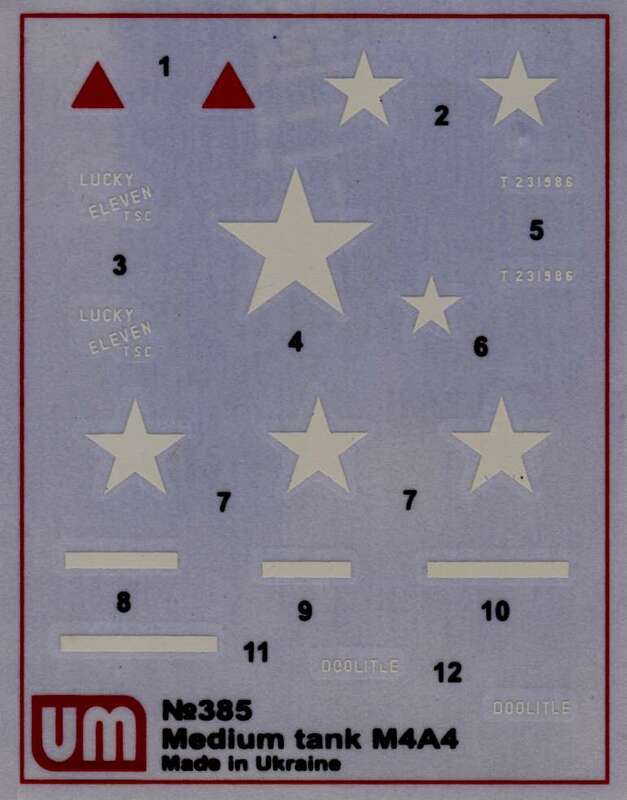 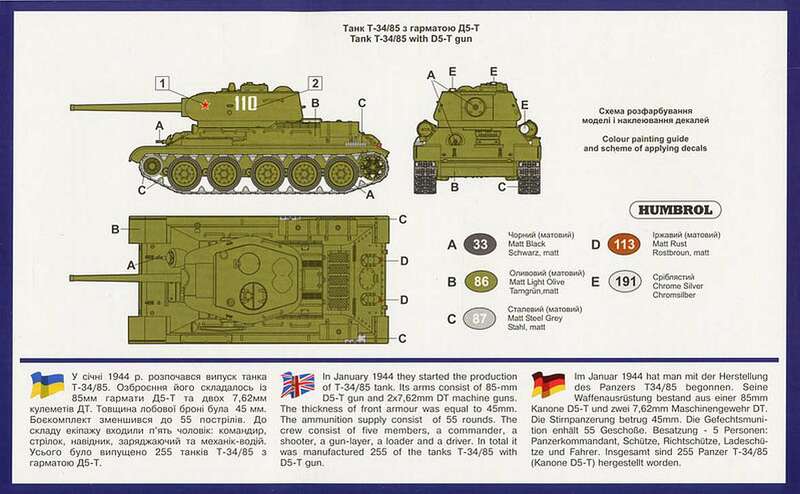 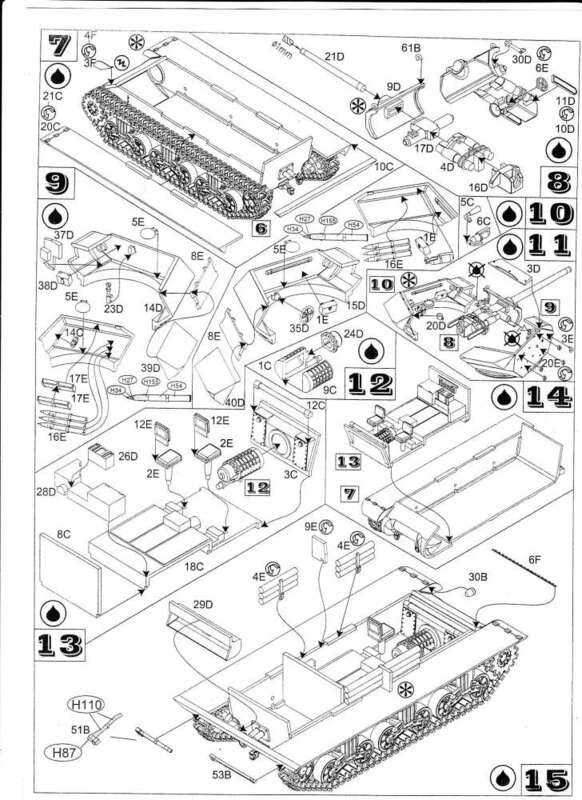 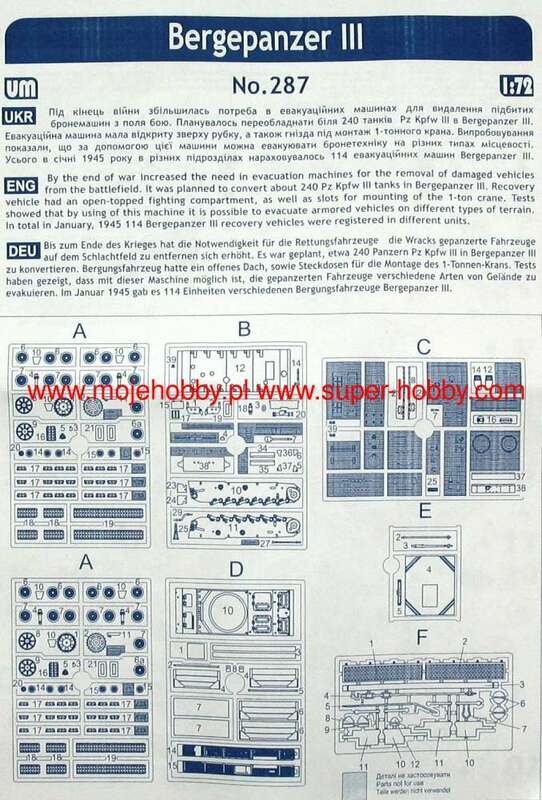 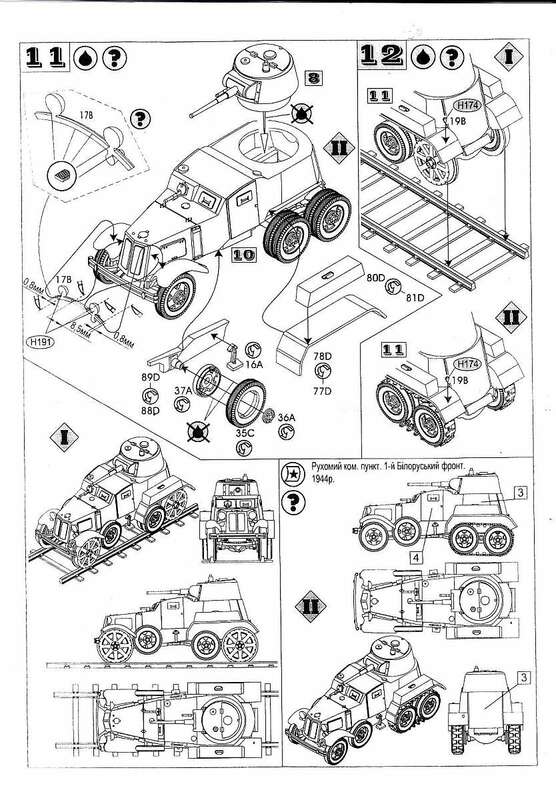 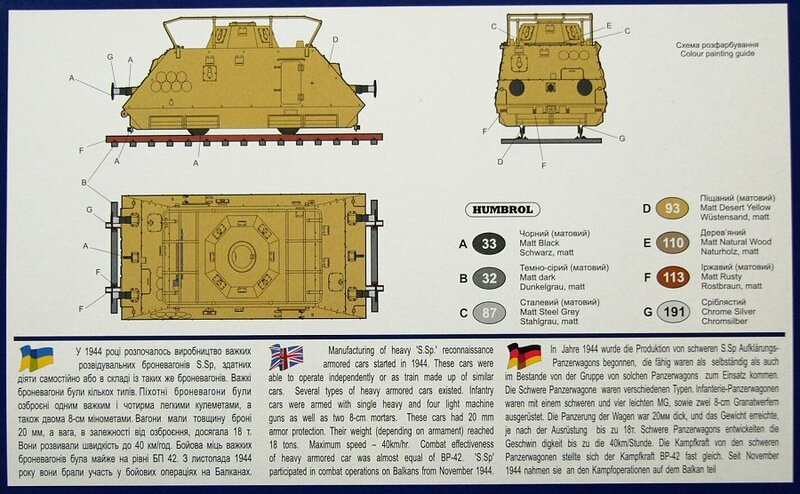 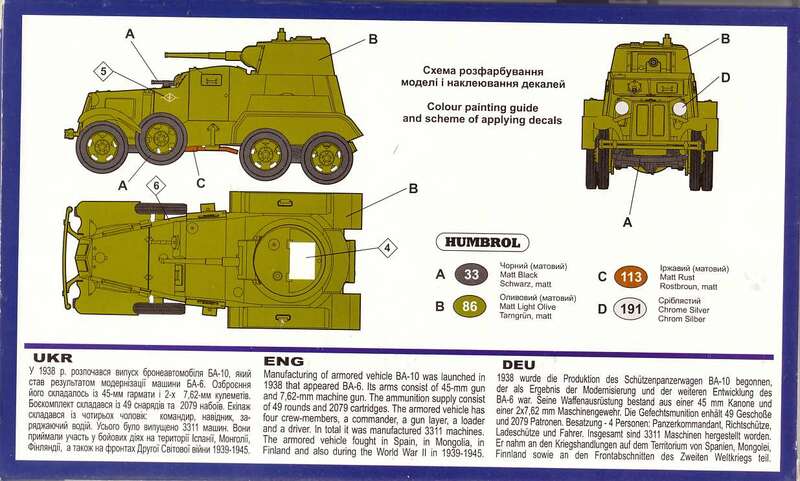 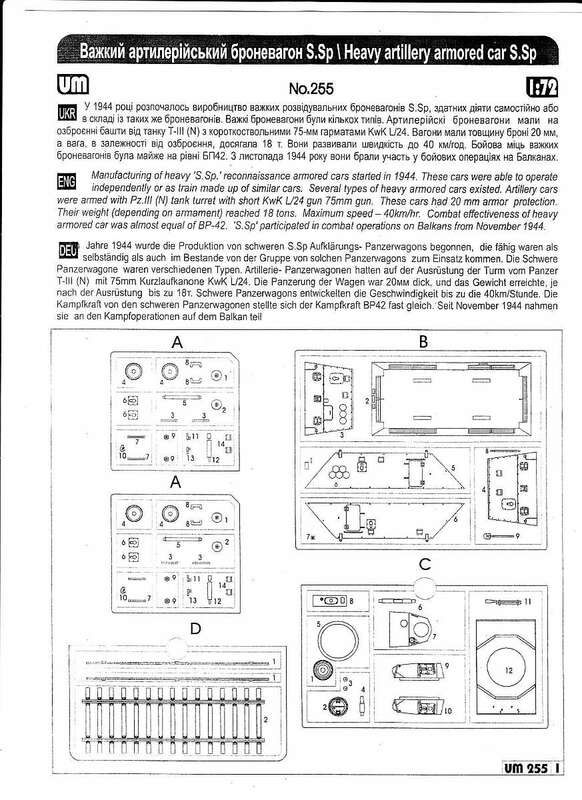 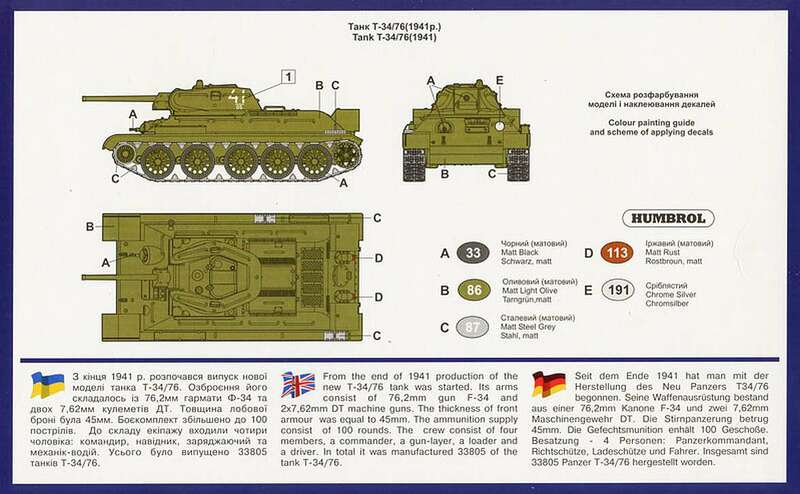 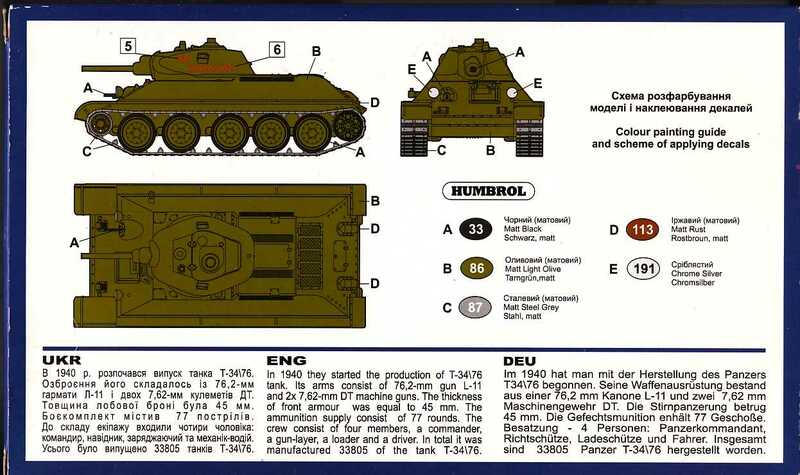 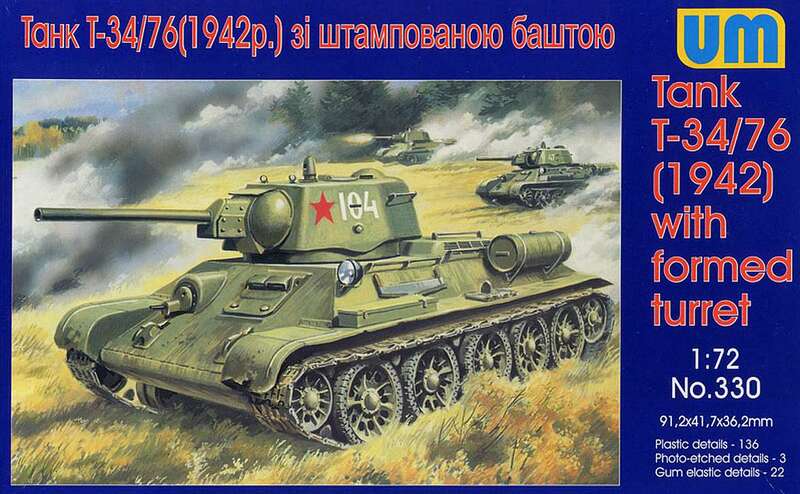 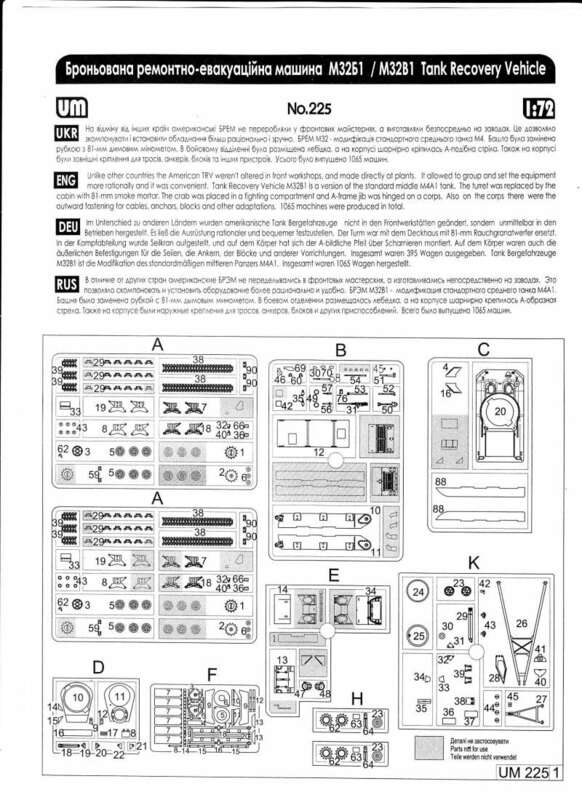 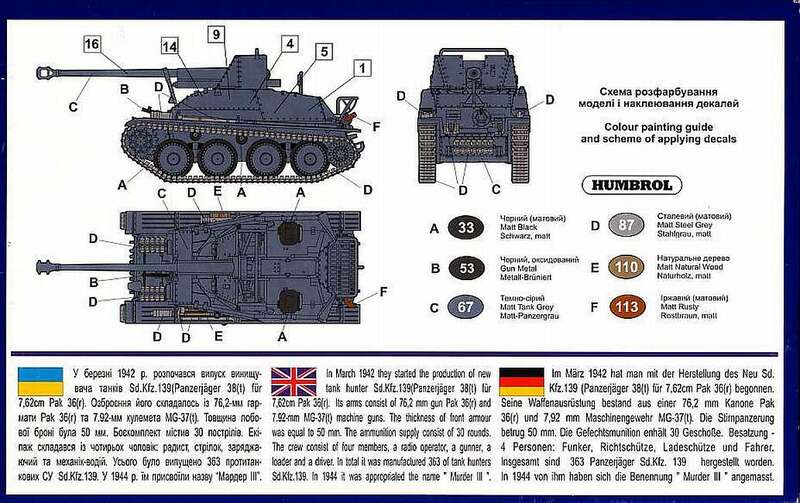 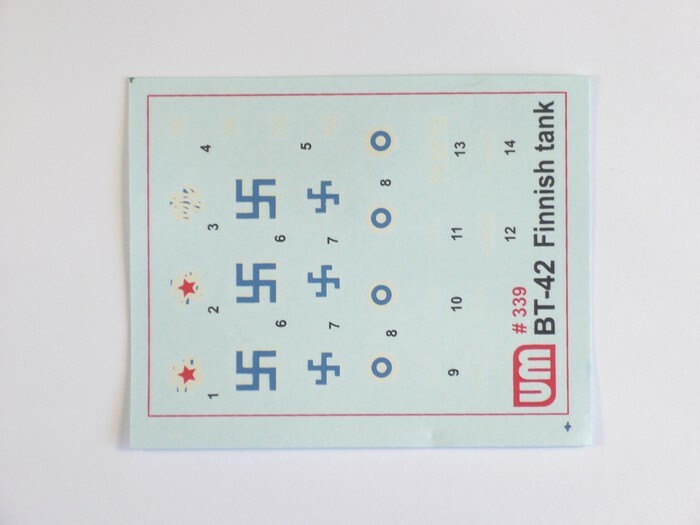 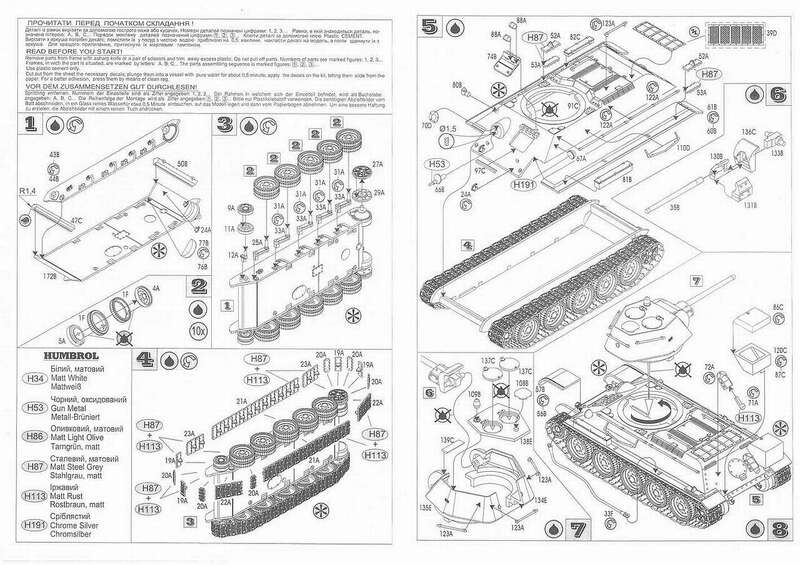 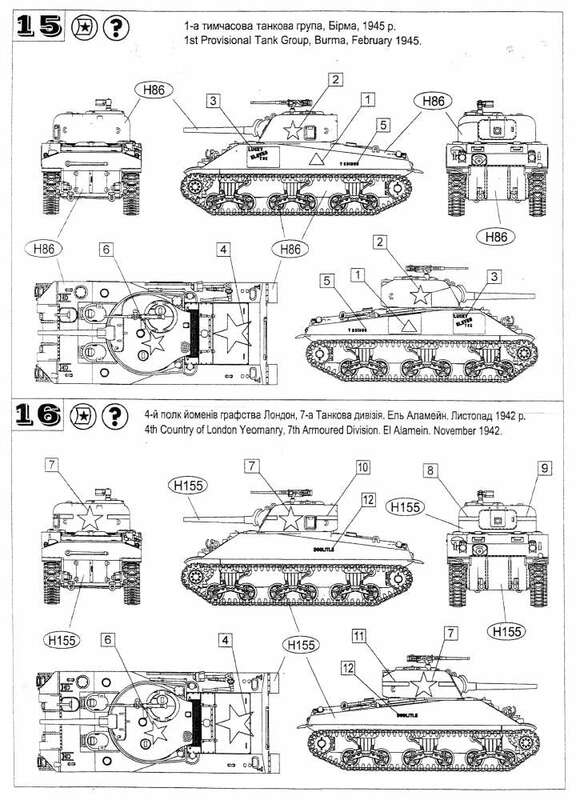 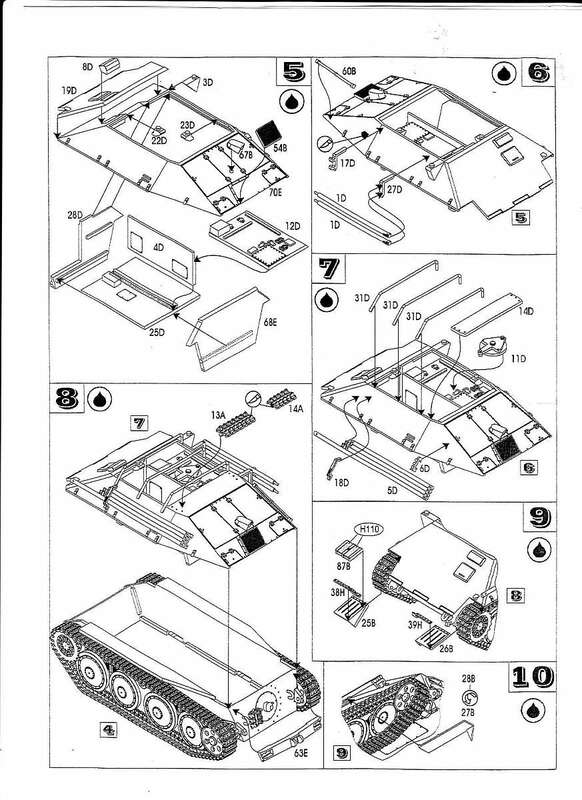 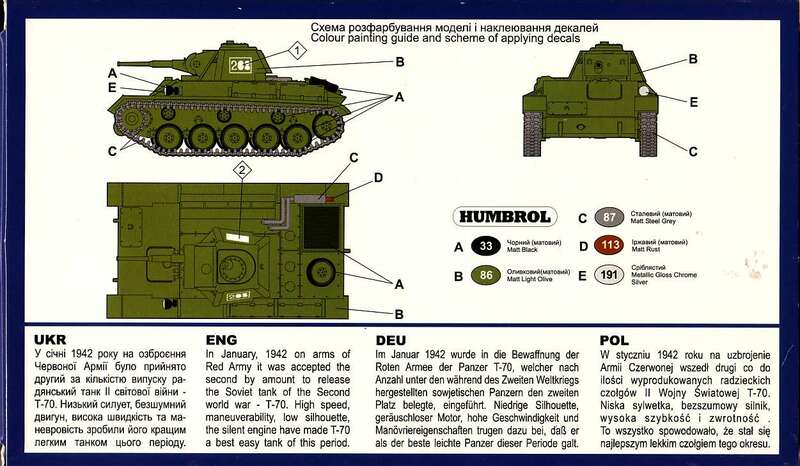 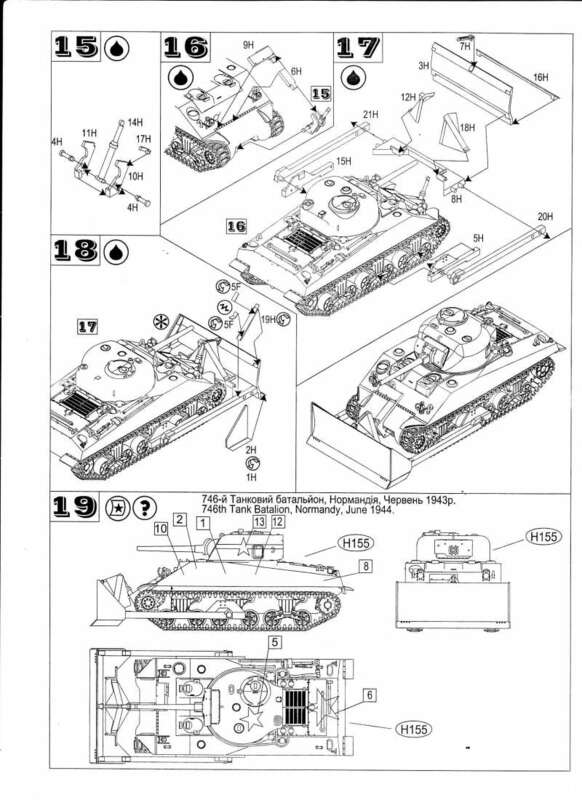 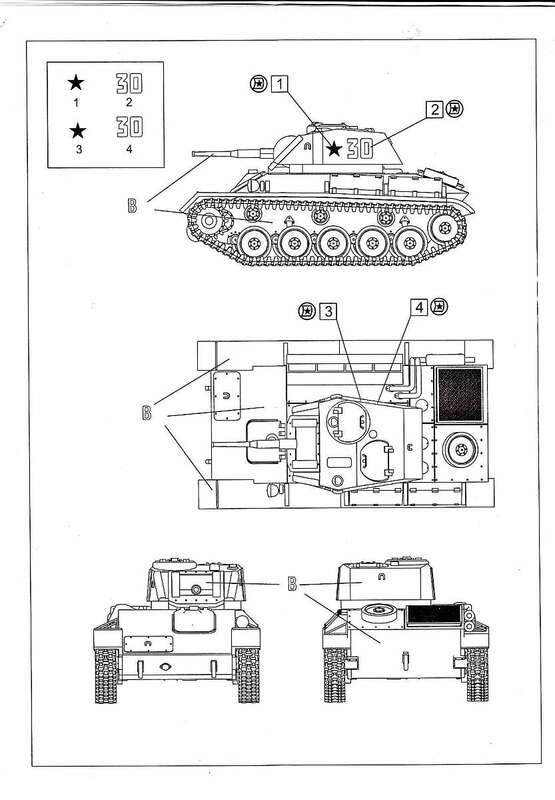 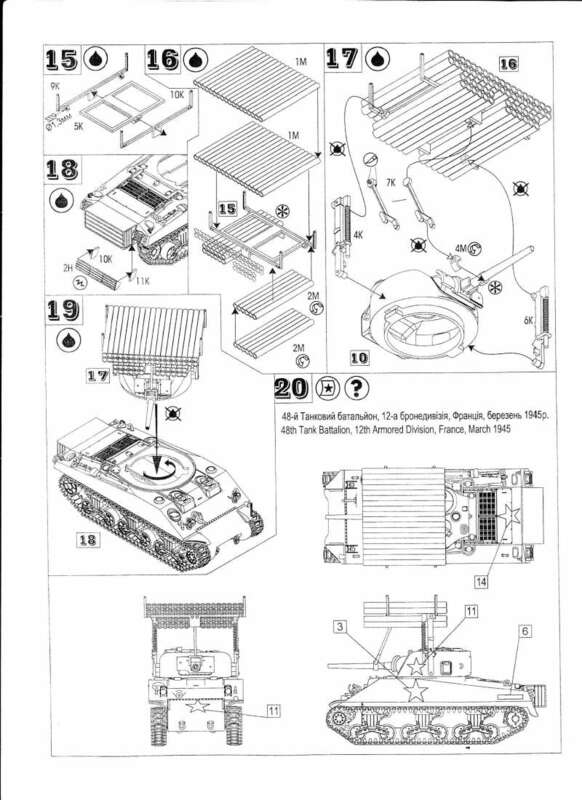 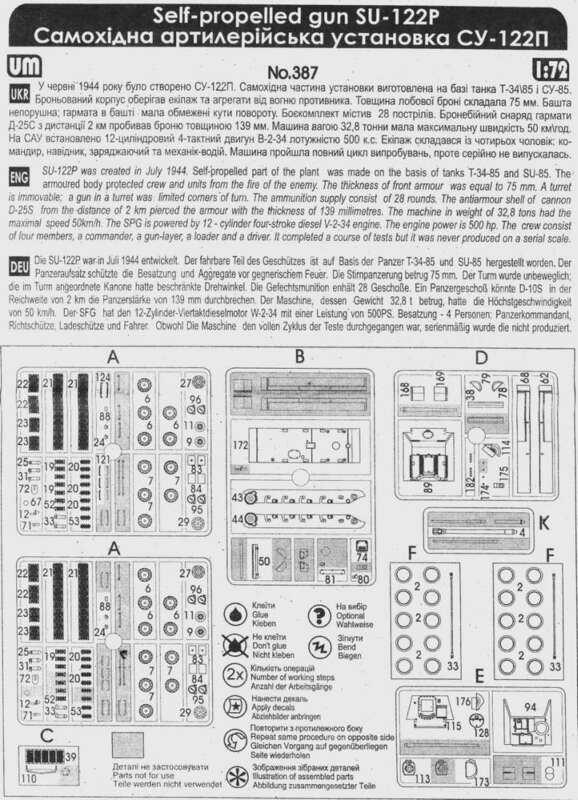 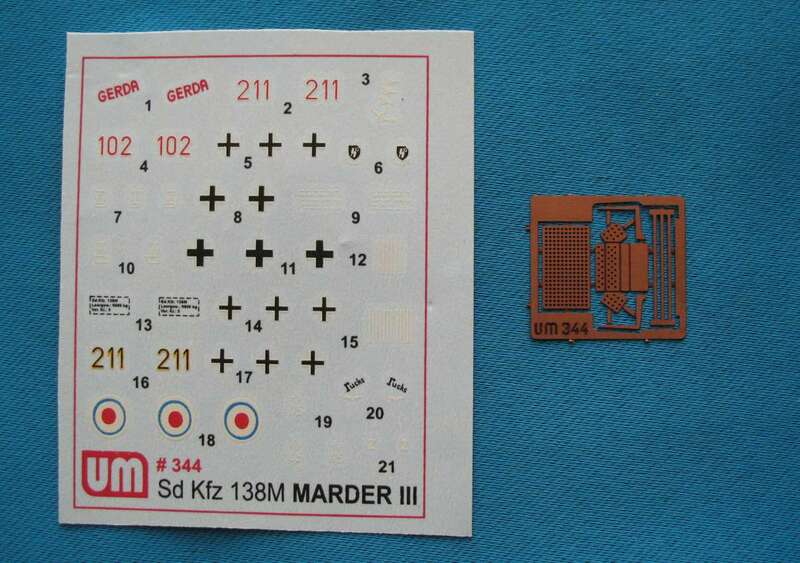 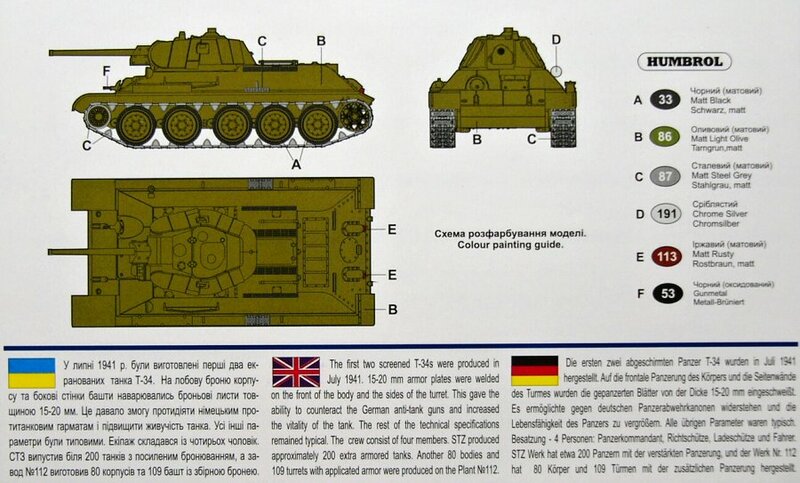 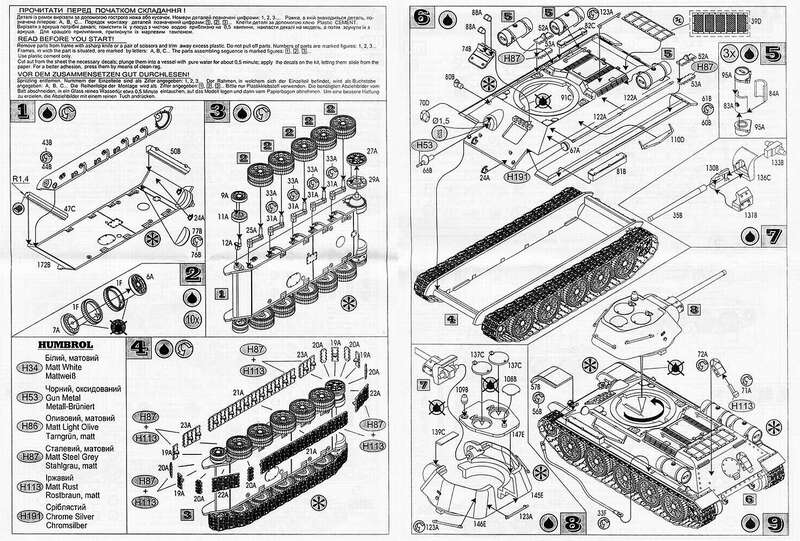 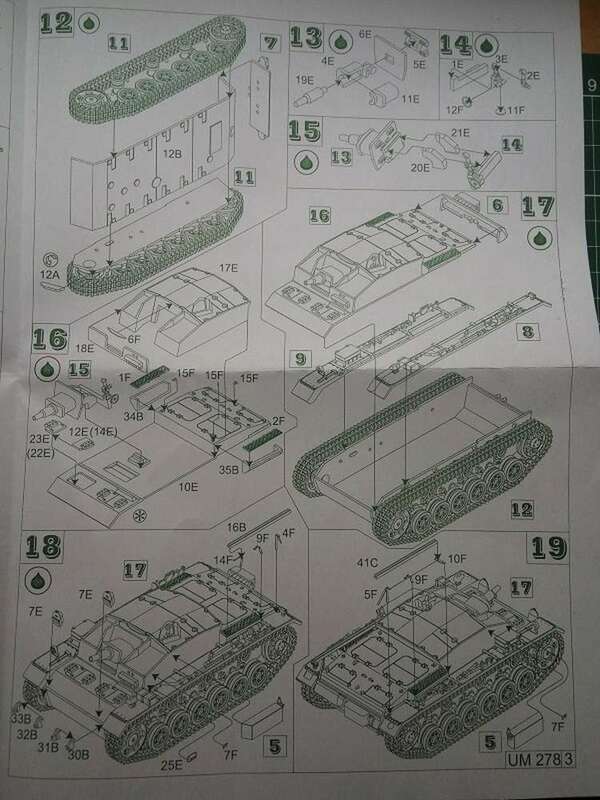 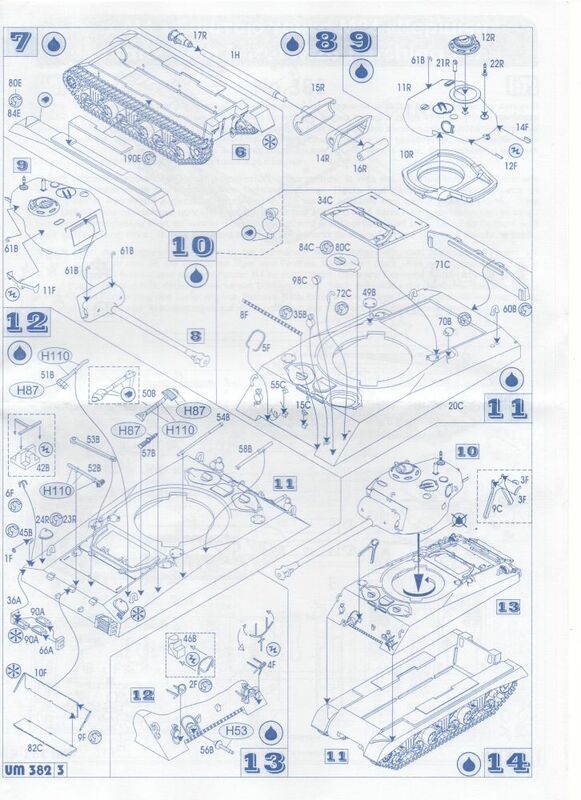 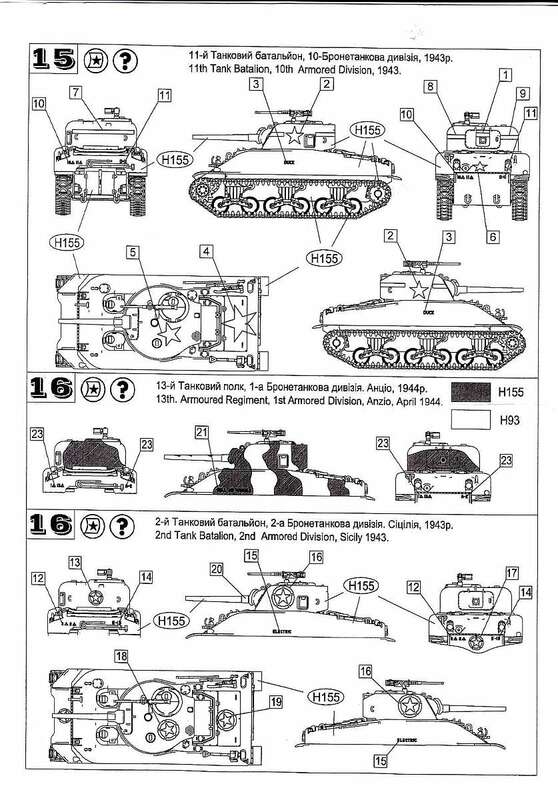 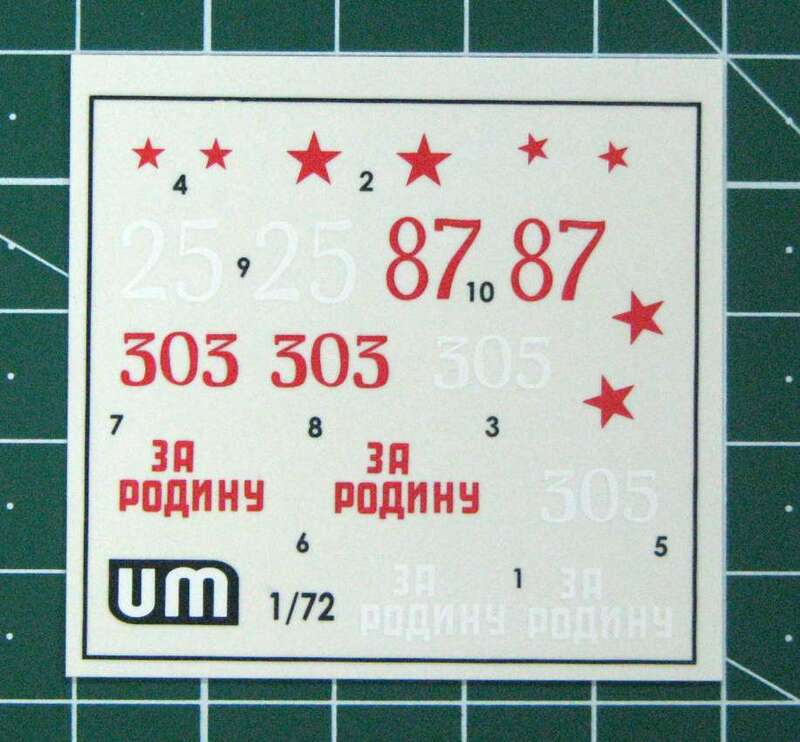 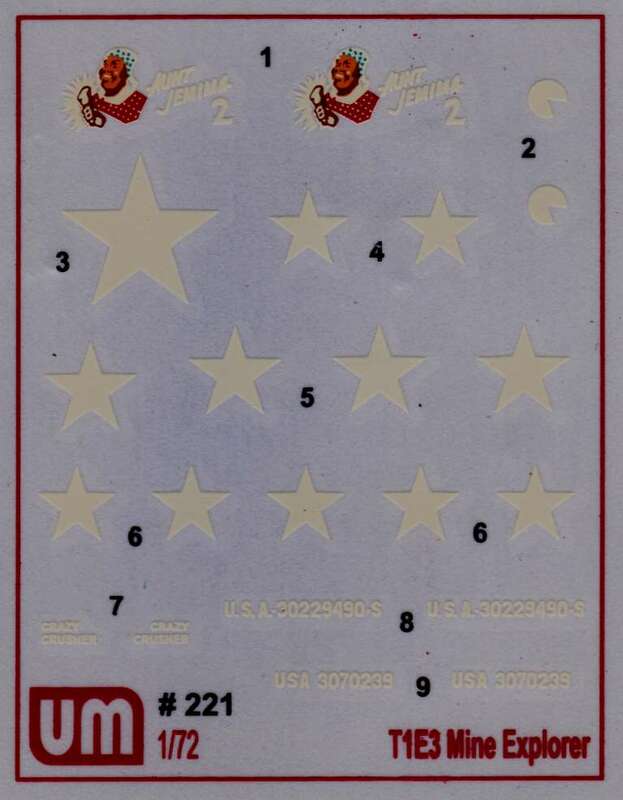 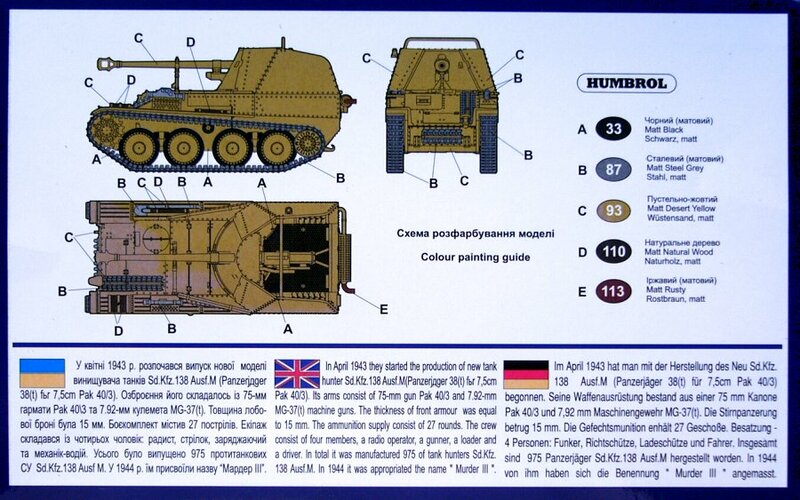 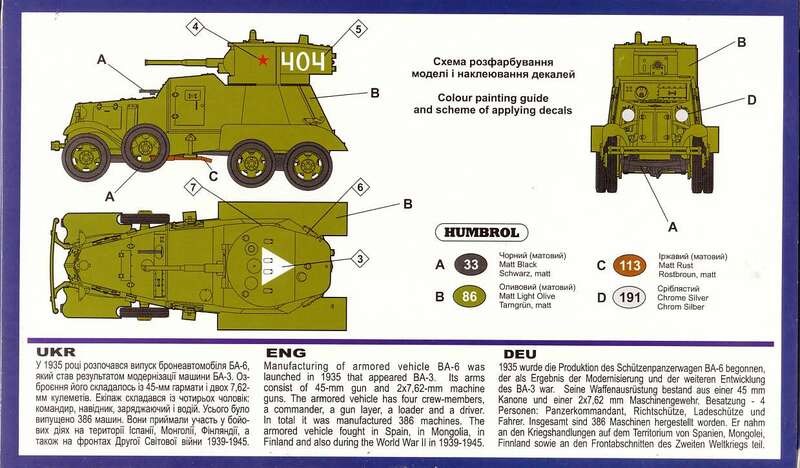 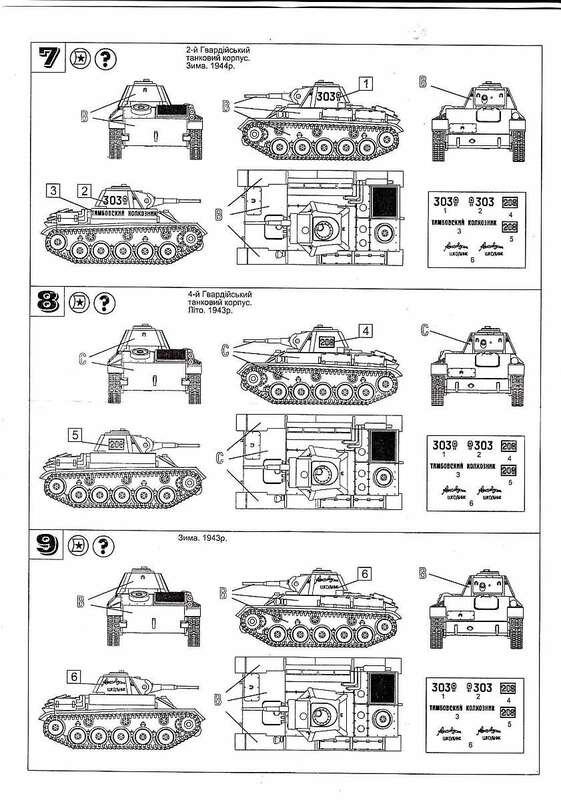 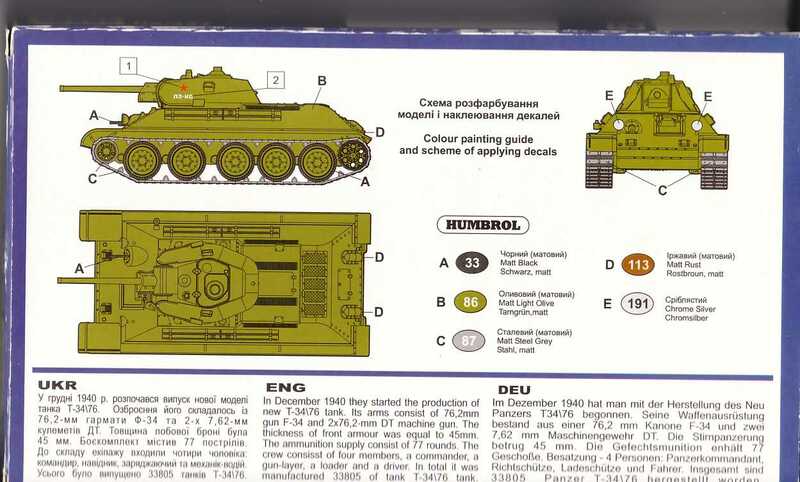 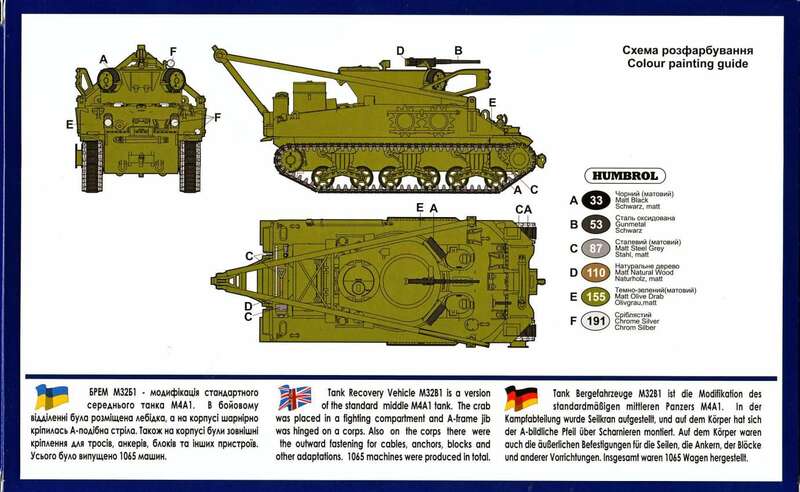 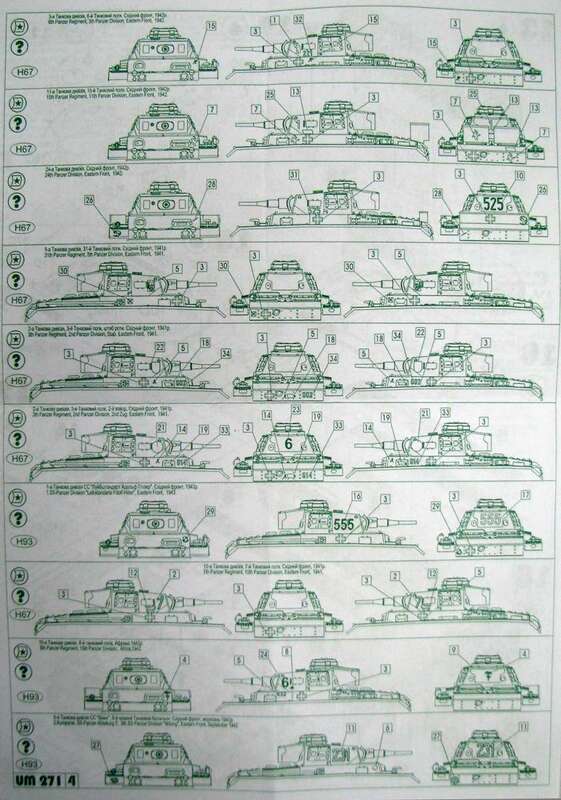 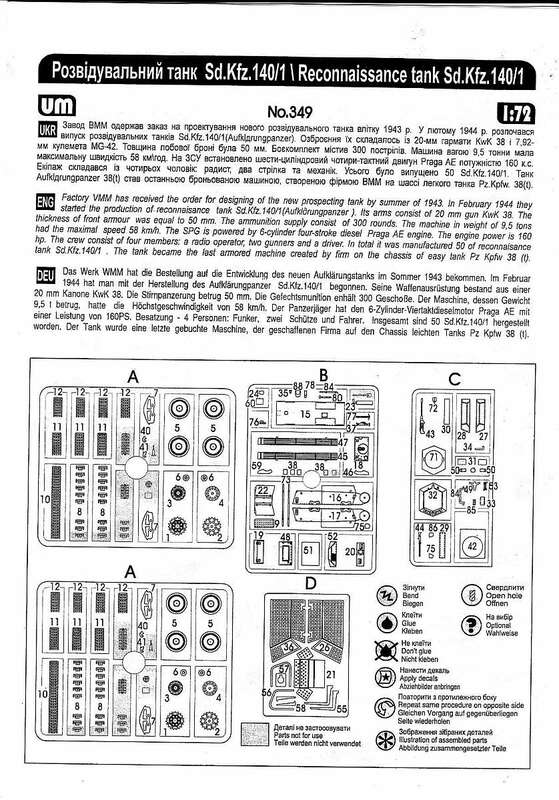 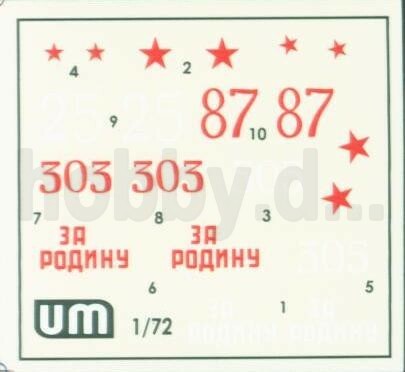 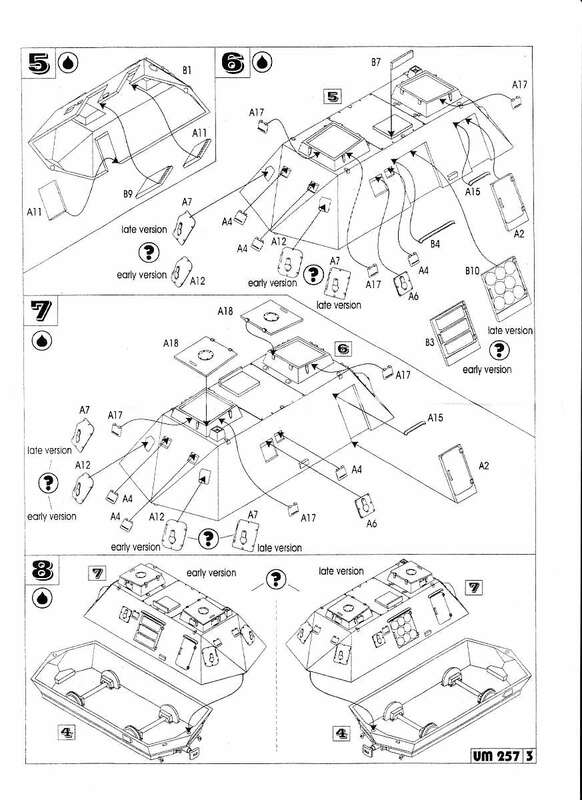 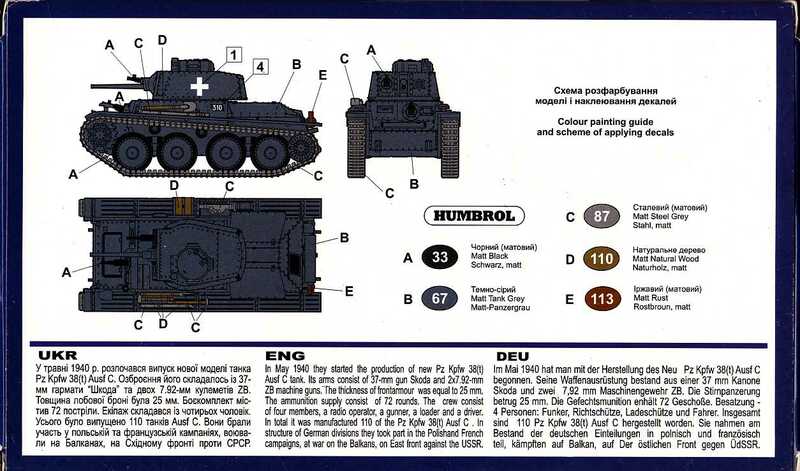 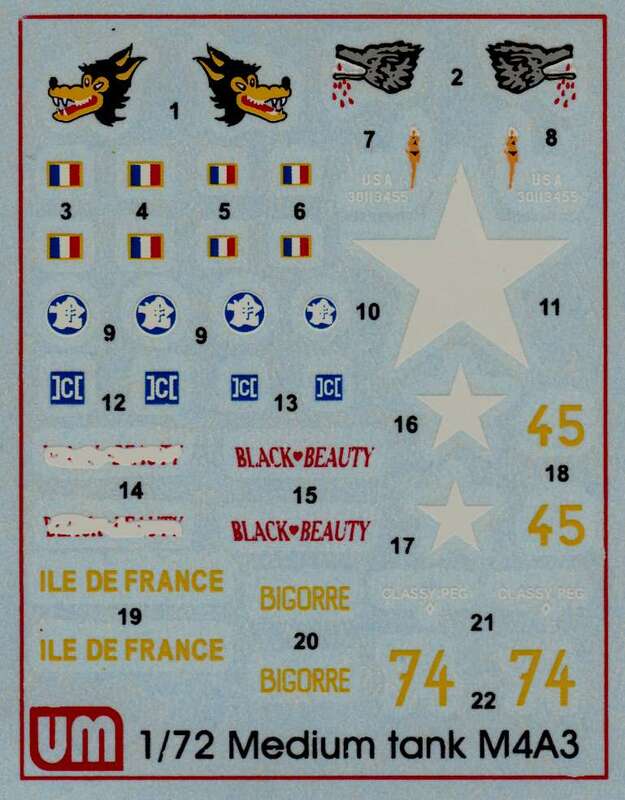 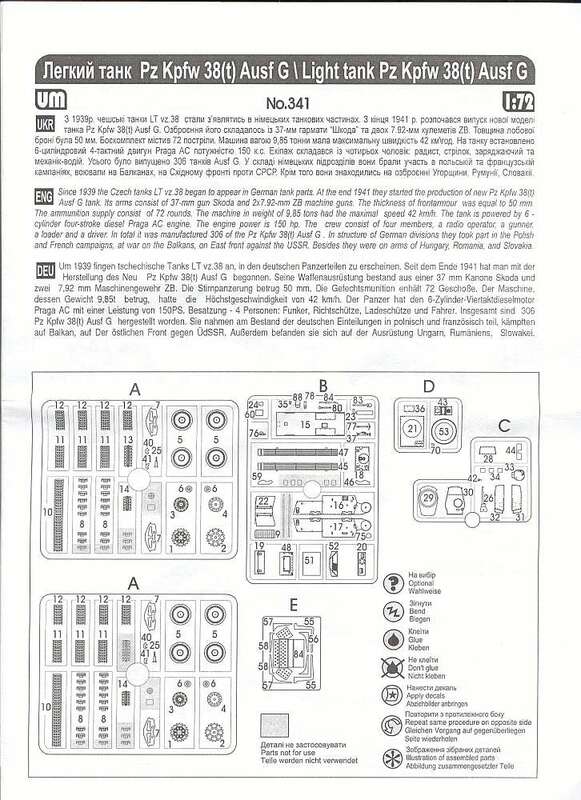 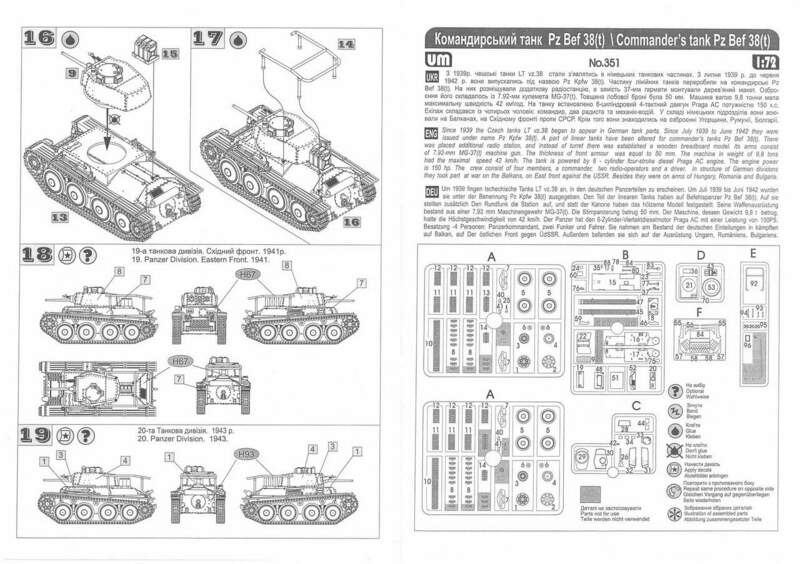 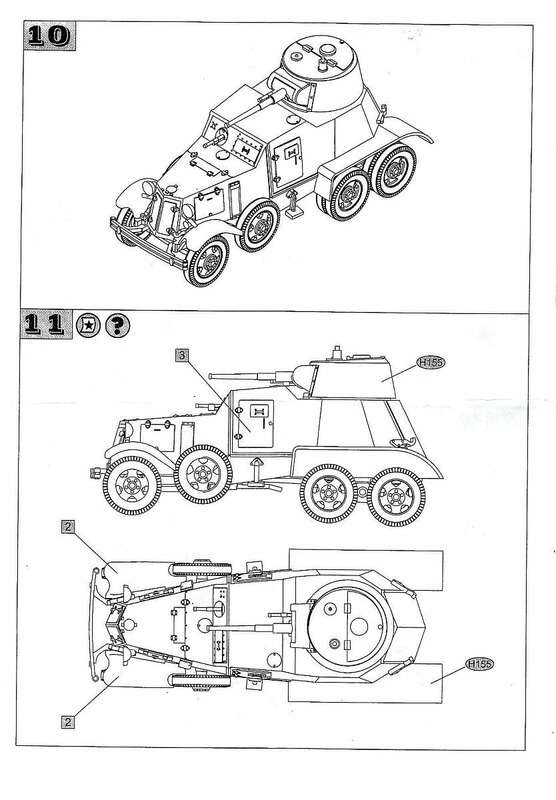 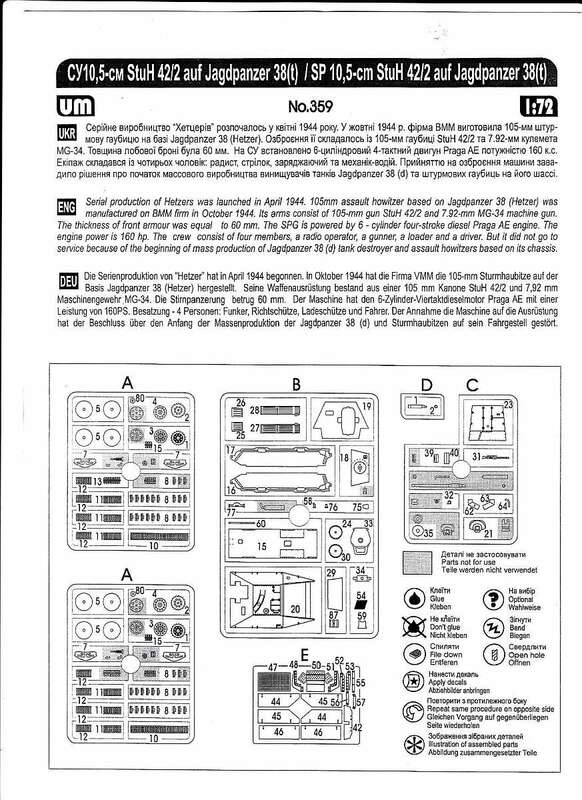 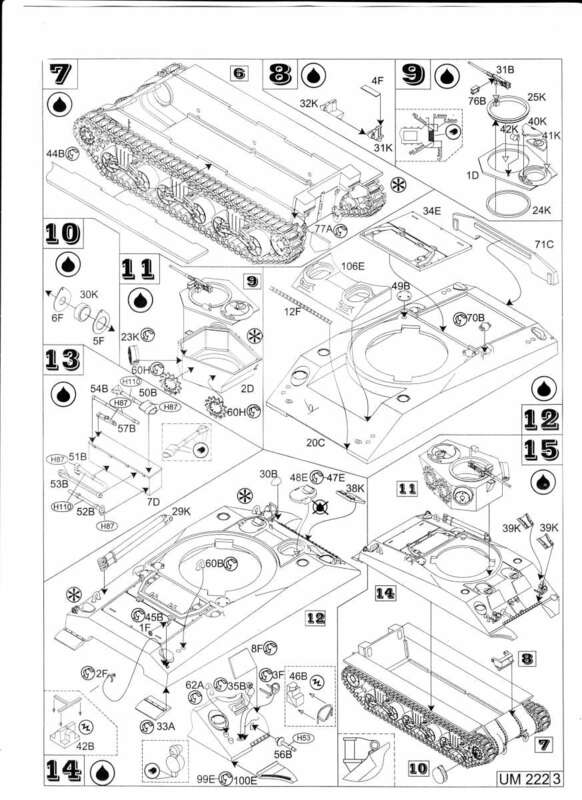 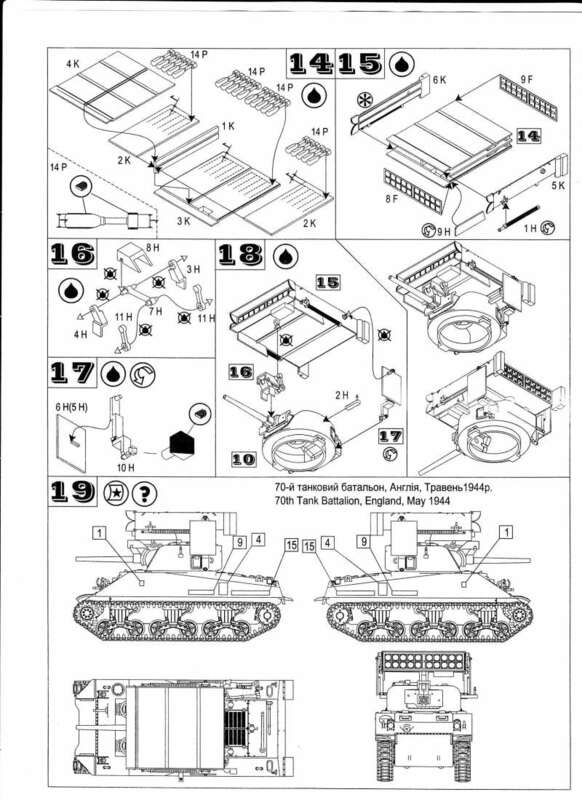 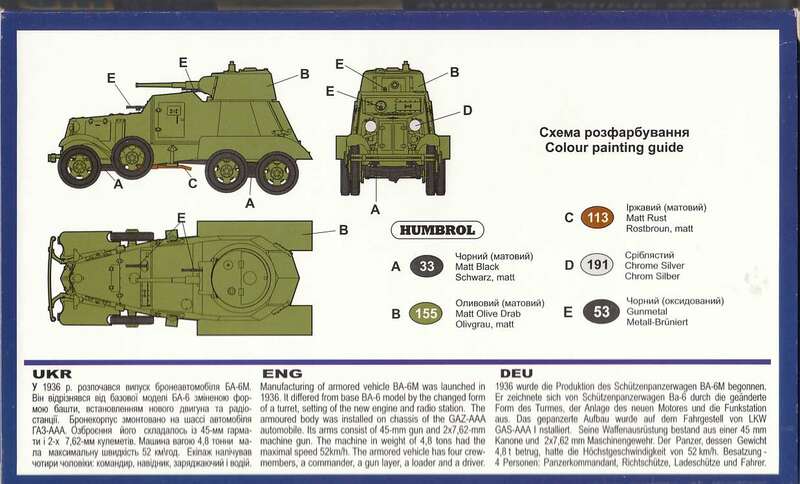 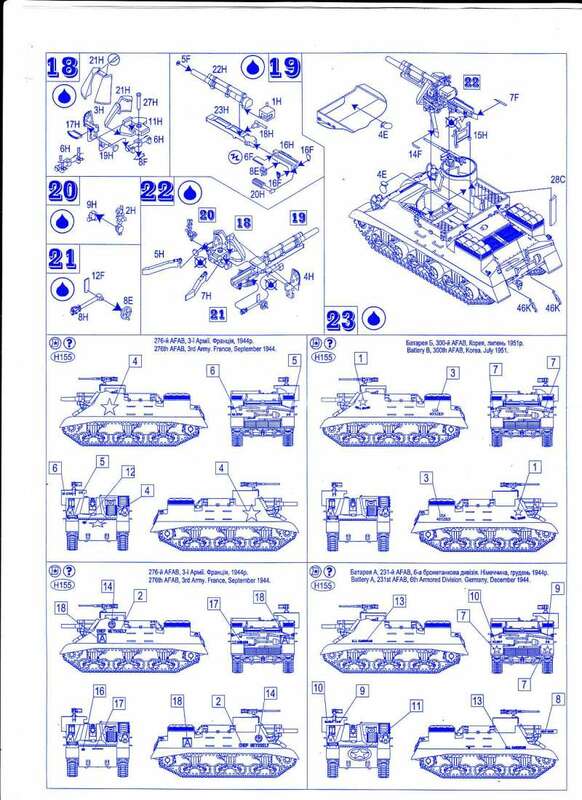 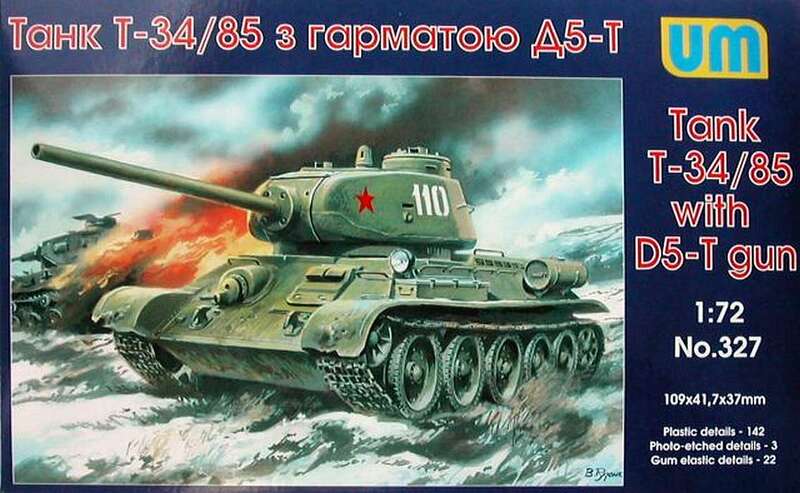 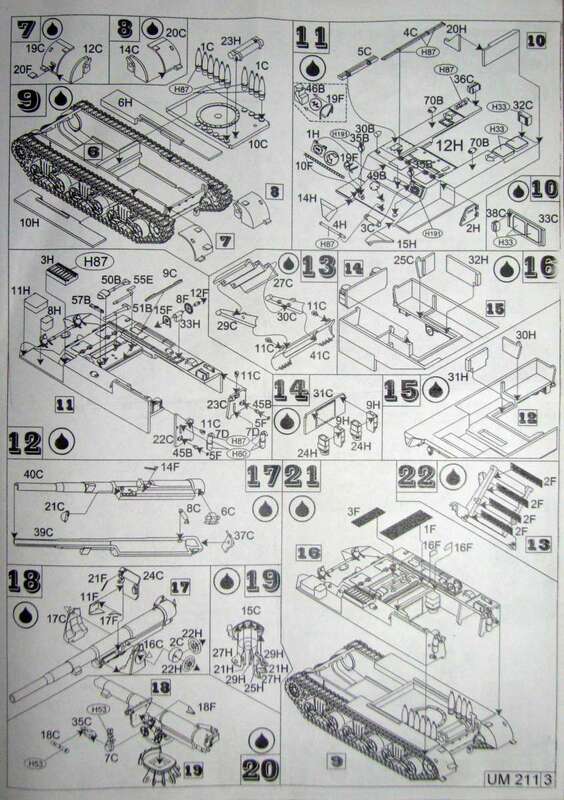 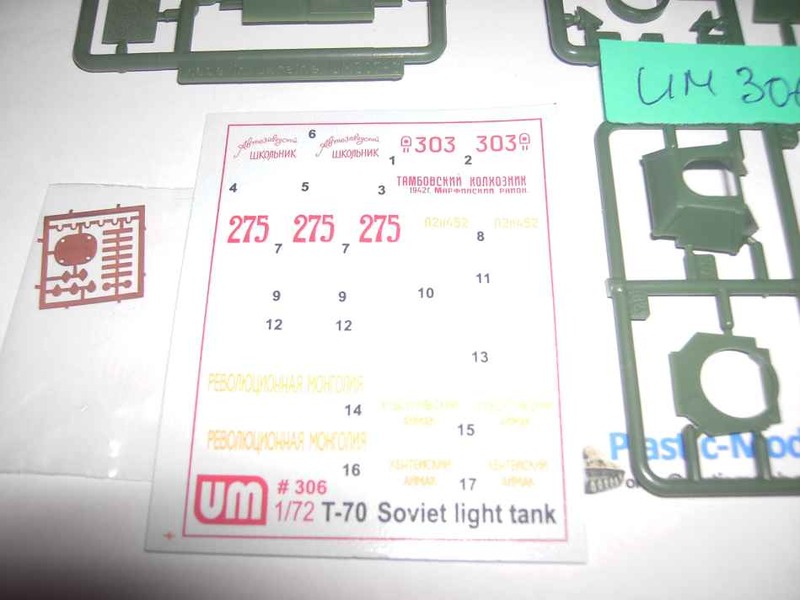 The decal sheet has markings for just the one Soviet tank (a colour three view is on the back of the box). 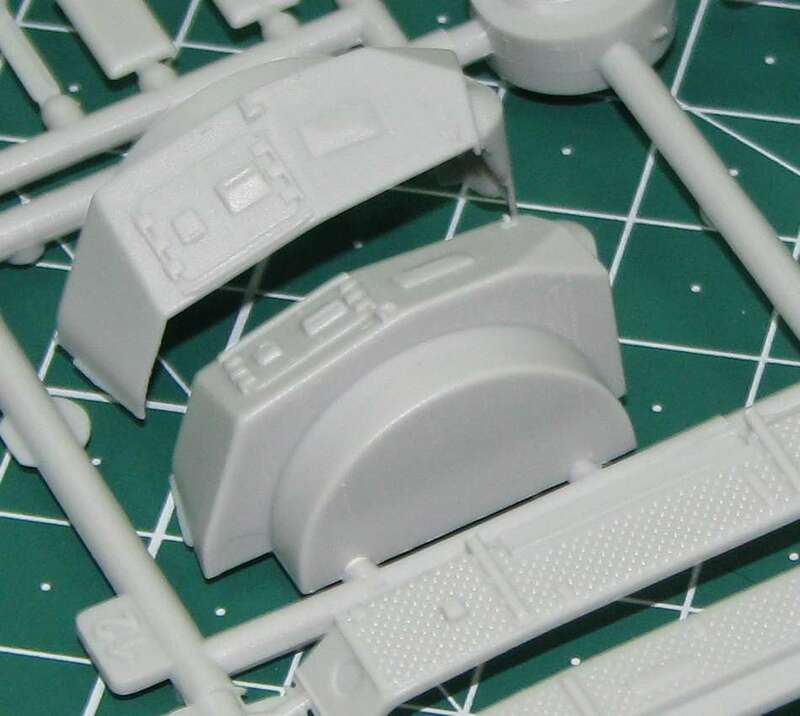 All road wheels and suspension arms are separate mouldings, the gun and turret are designed to move and upper hull accessories include ammo boxes, lights, towing hook and a spare wheel. 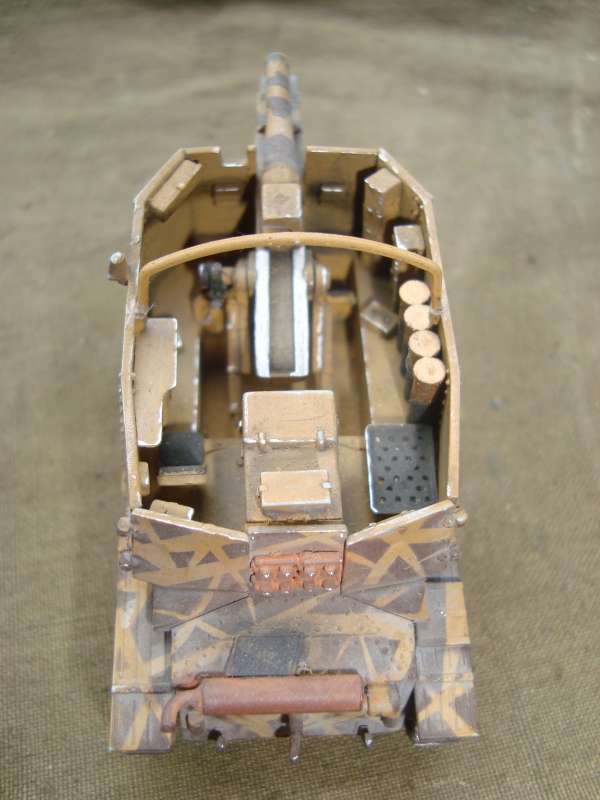 While there is no interior detail there are optional position hatched in the turret and at the front of the upper hull. 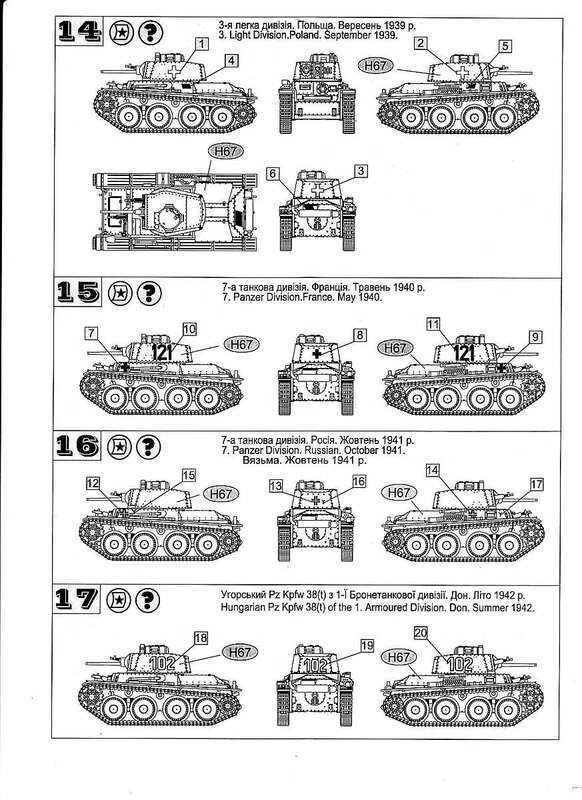 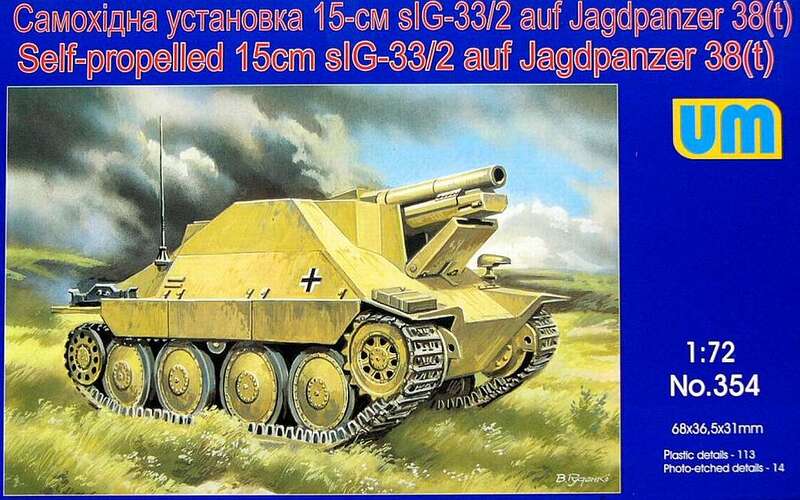 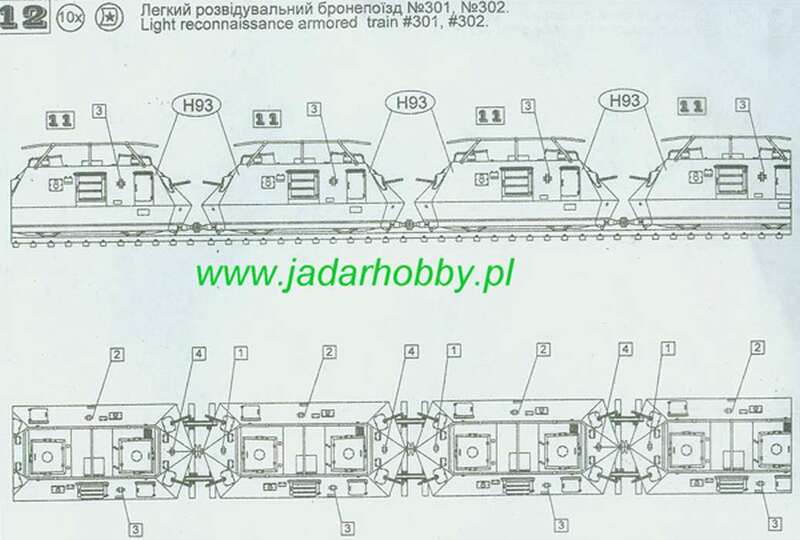 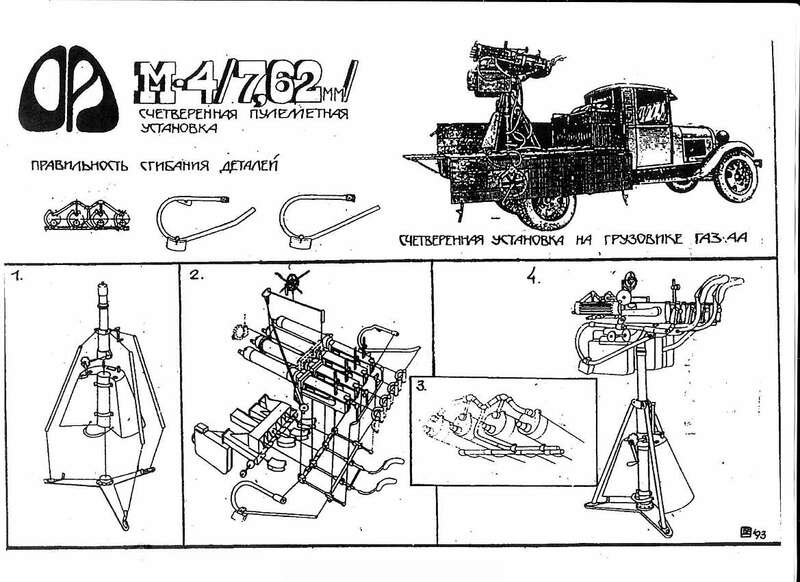 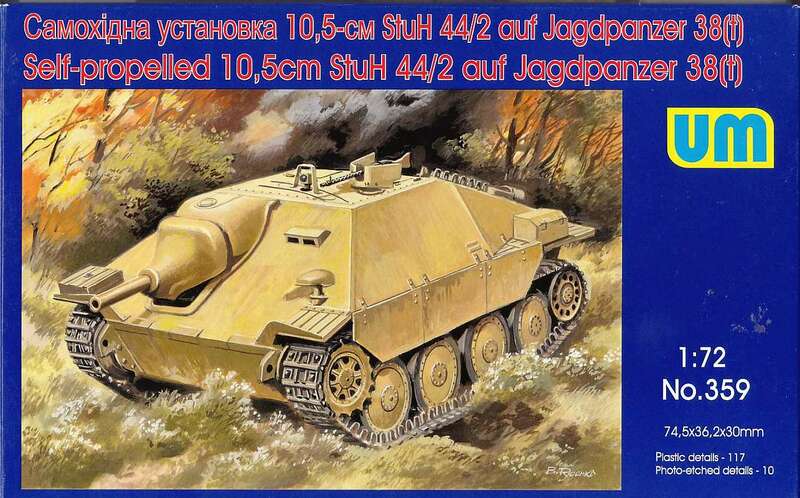 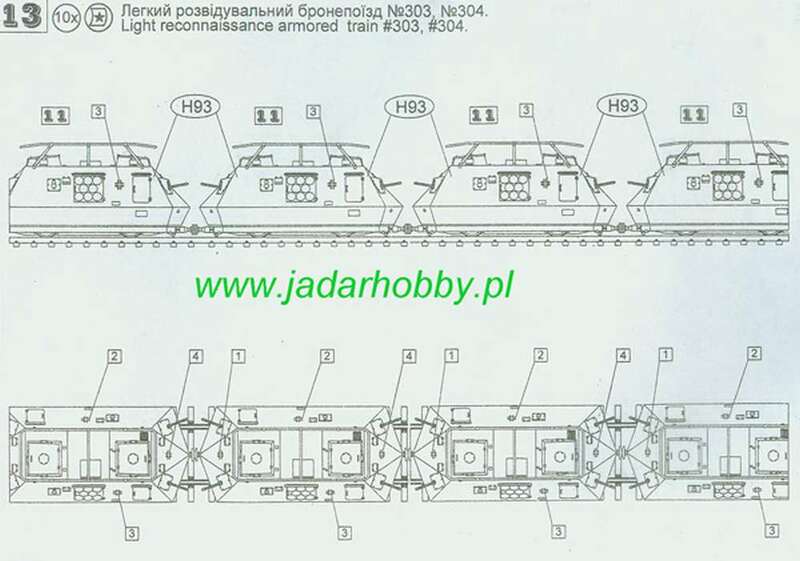 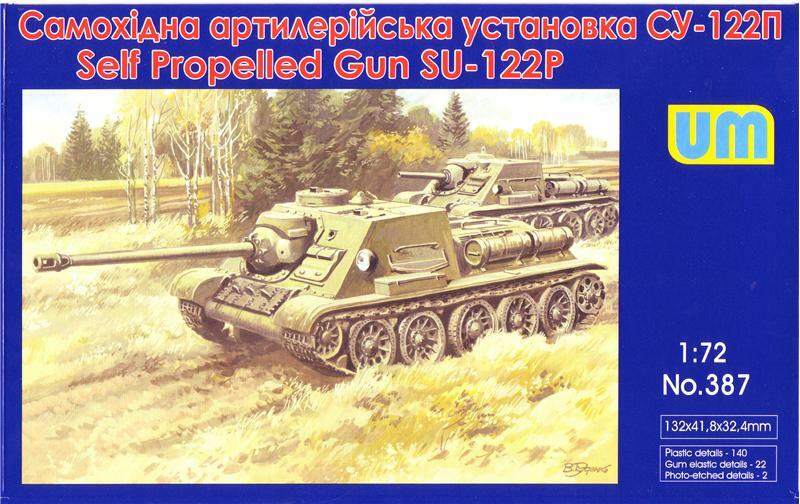 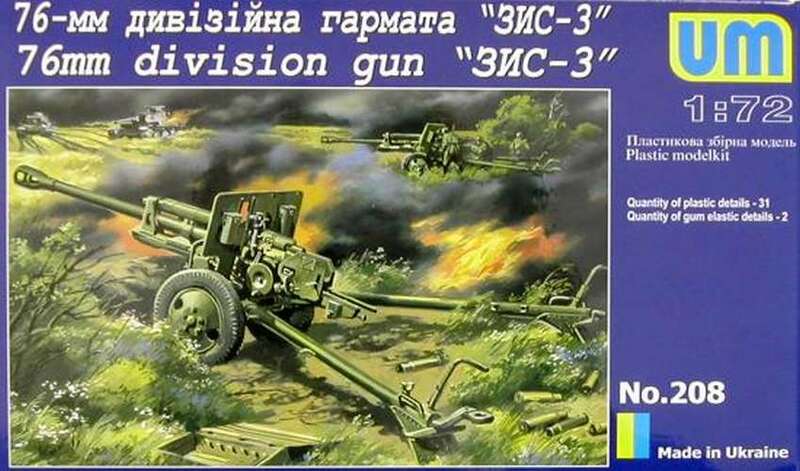 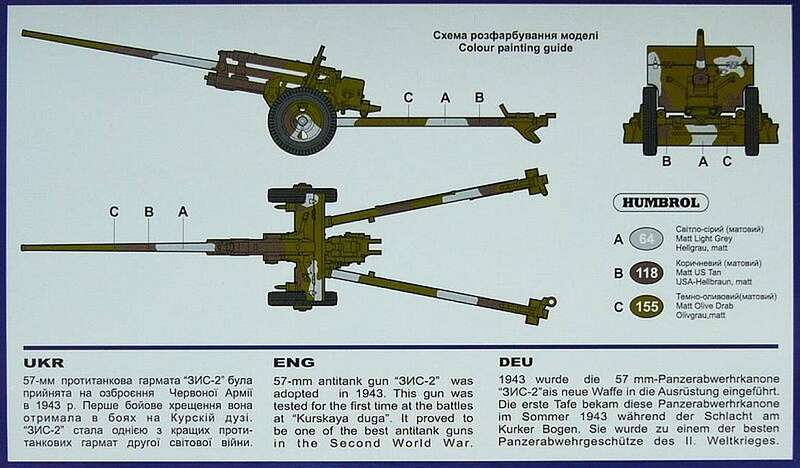 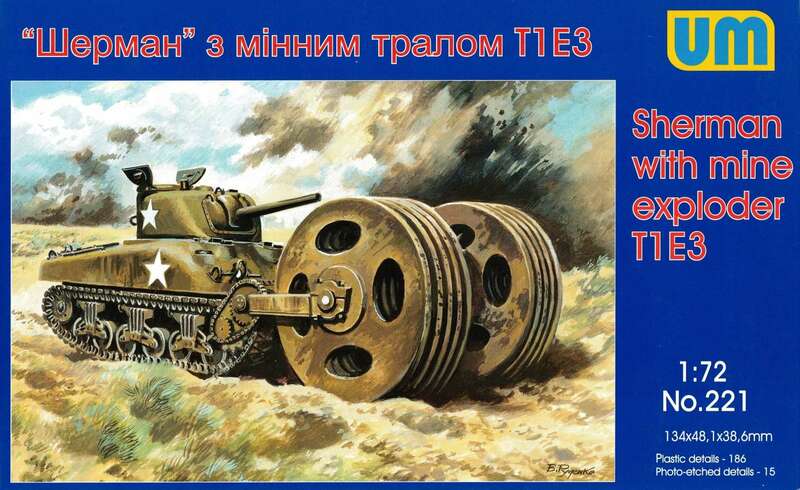 Same road wheels, 'link and length' tracks, lower hull and gun as the SU-76 but the rest is all new. 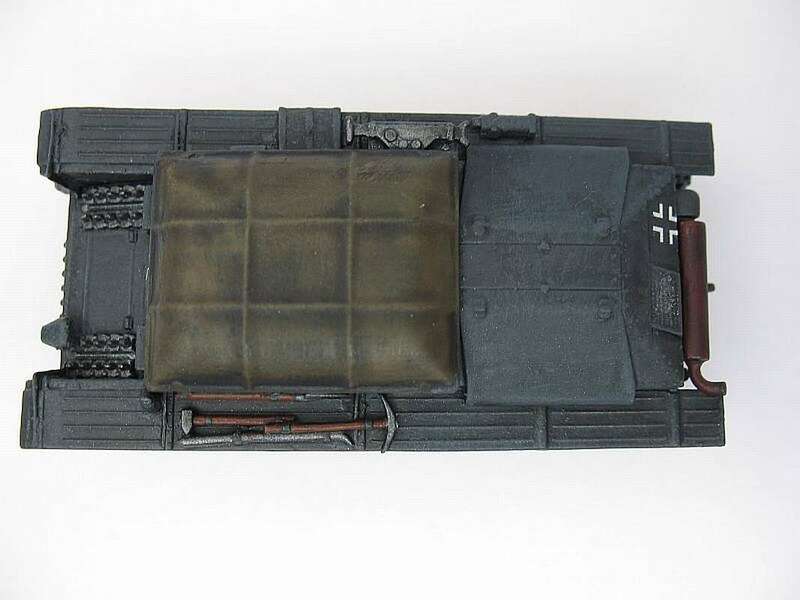 Not only is there the new upper hull, with it's 'open' rear section but it's fully detailed along with ammo boxes and 31 rounds of ammunition. 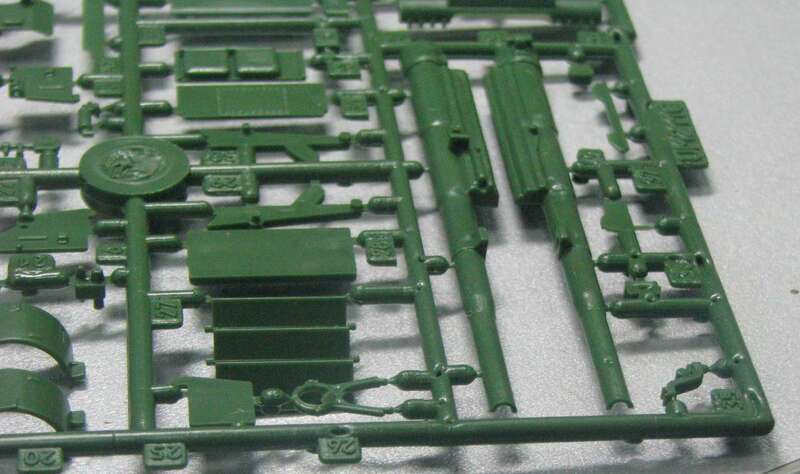 The back section of the gun is now included and it's fully detailed as well. 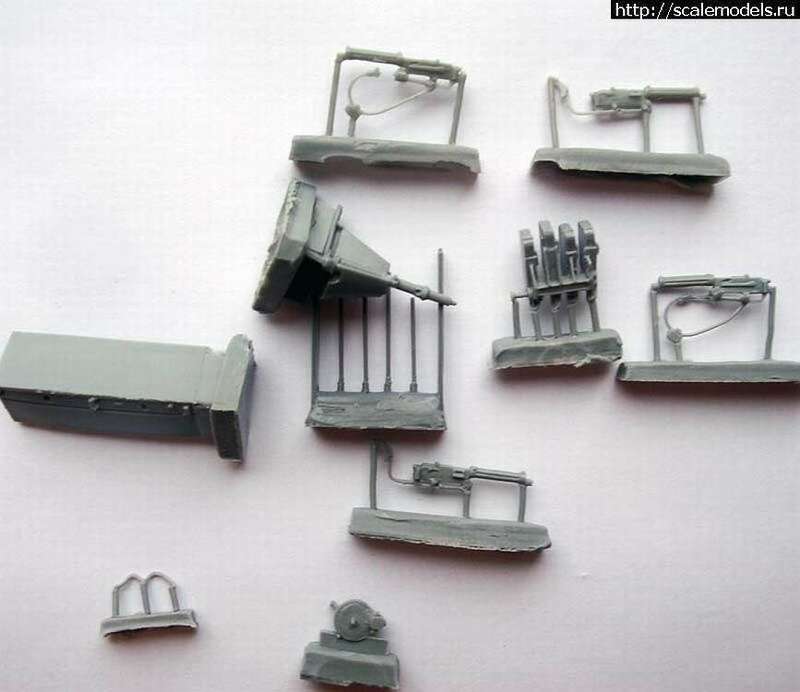 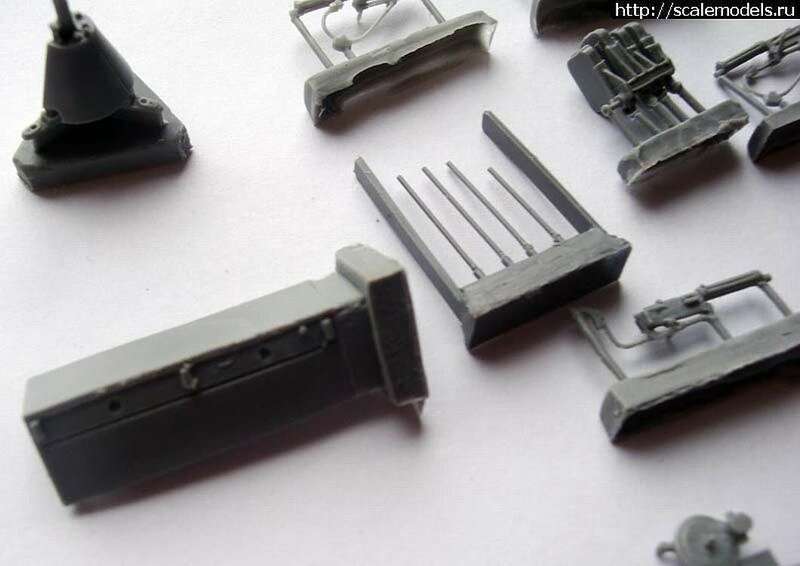 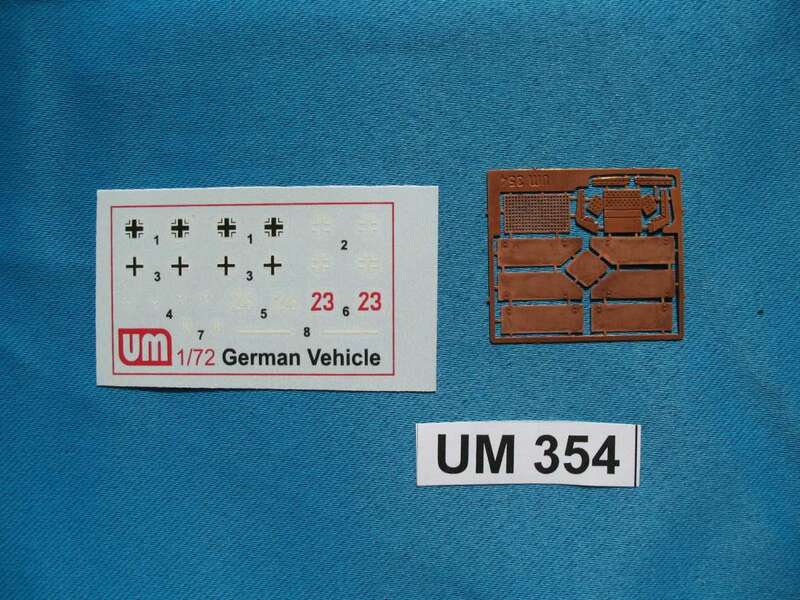 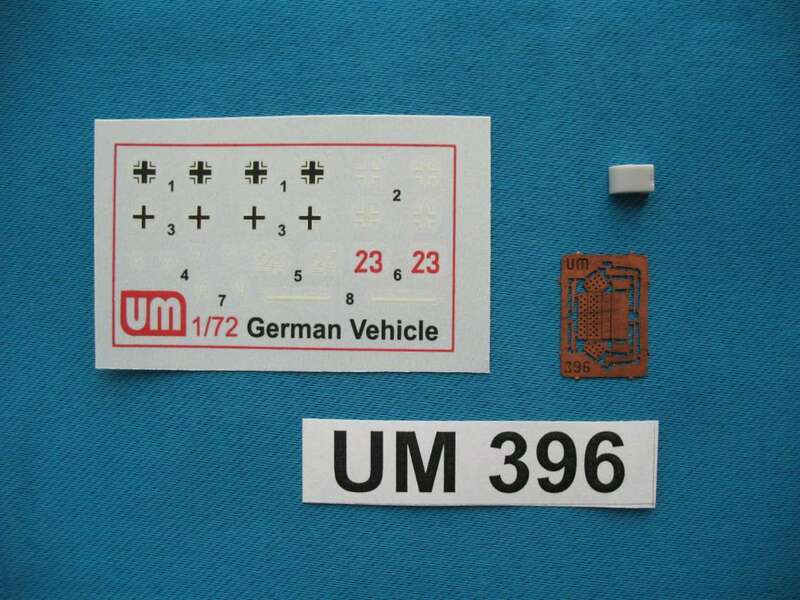 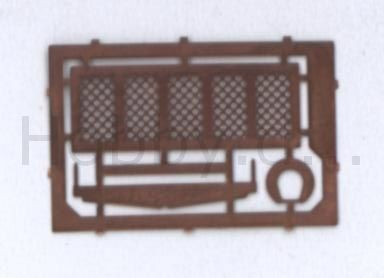 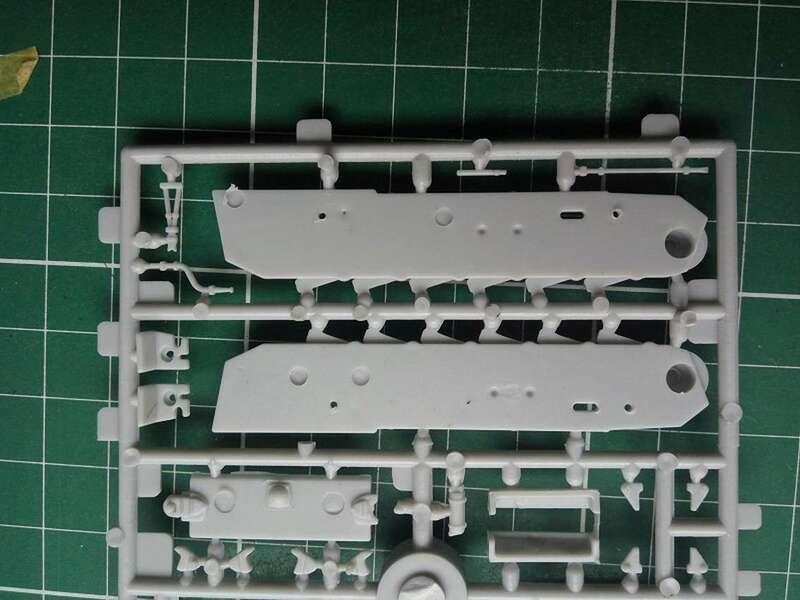 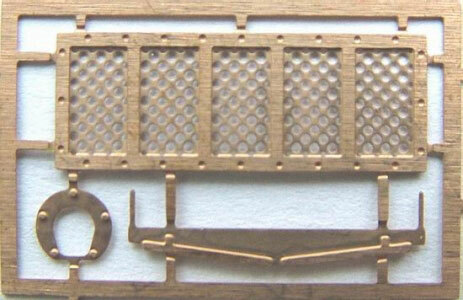 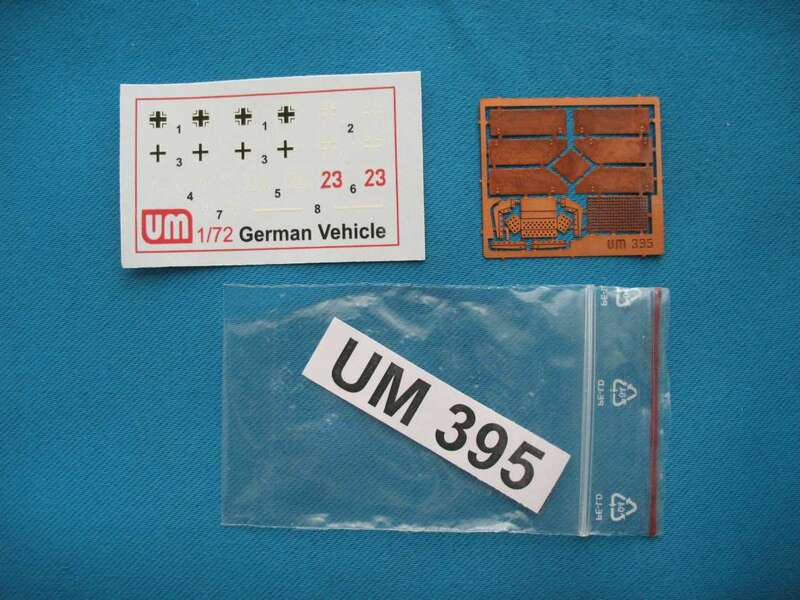 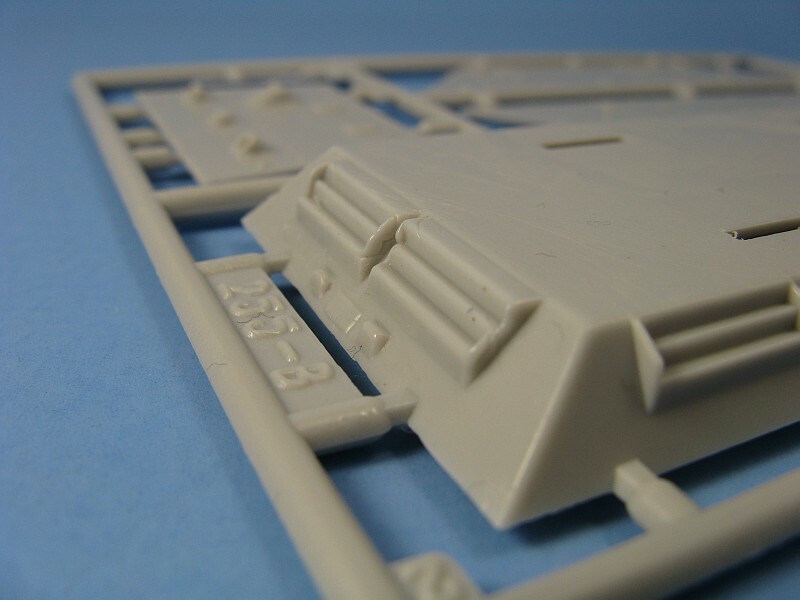 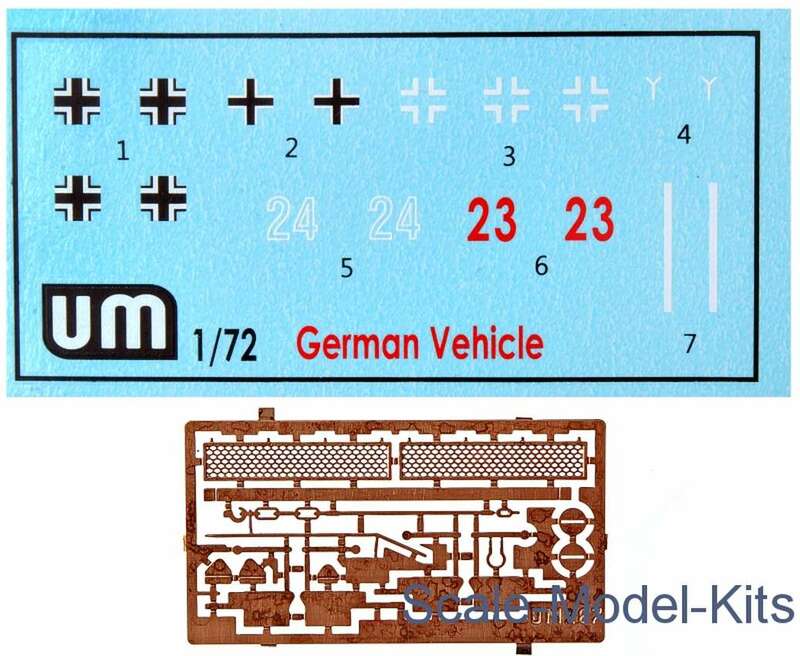 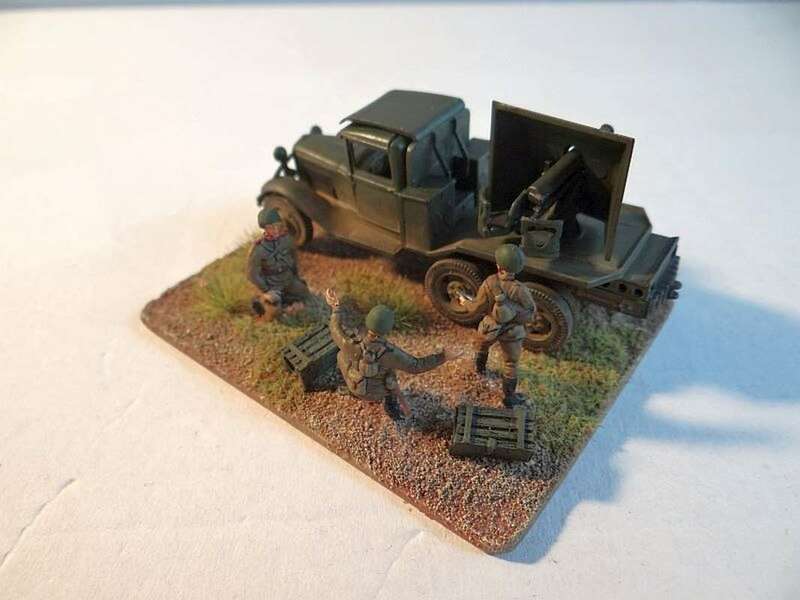 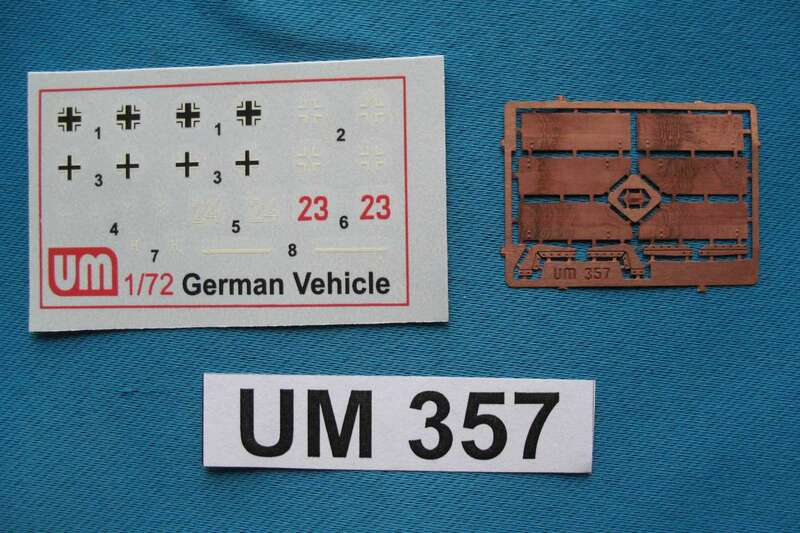 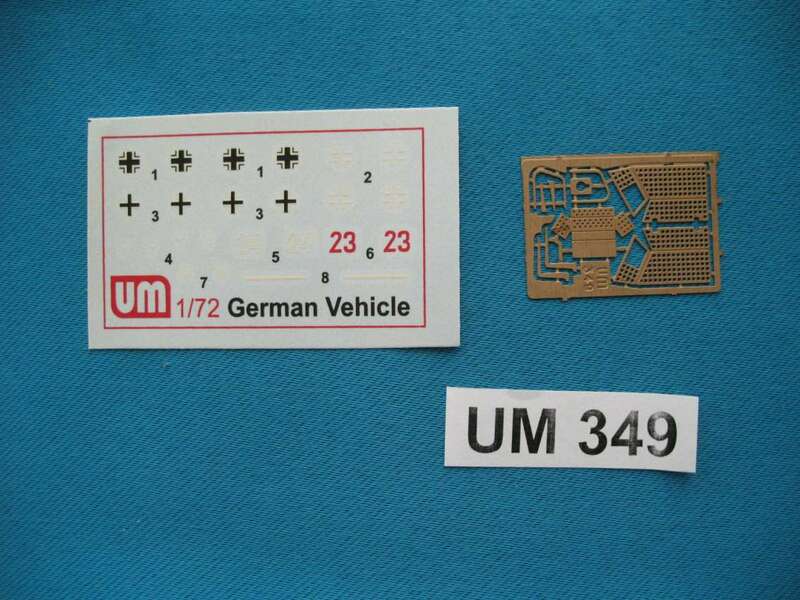 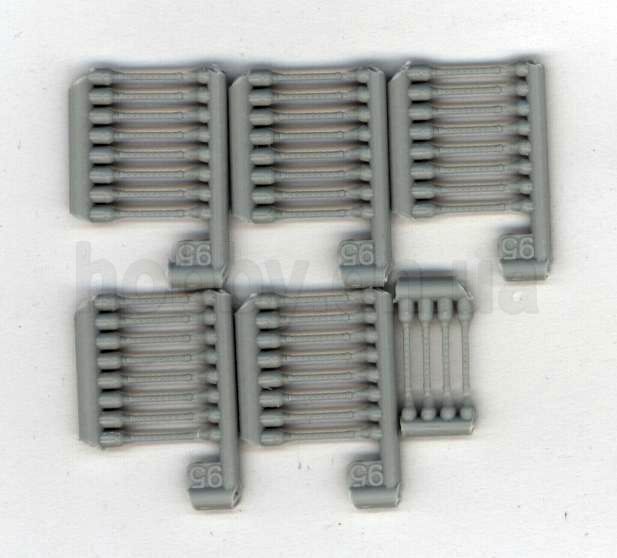 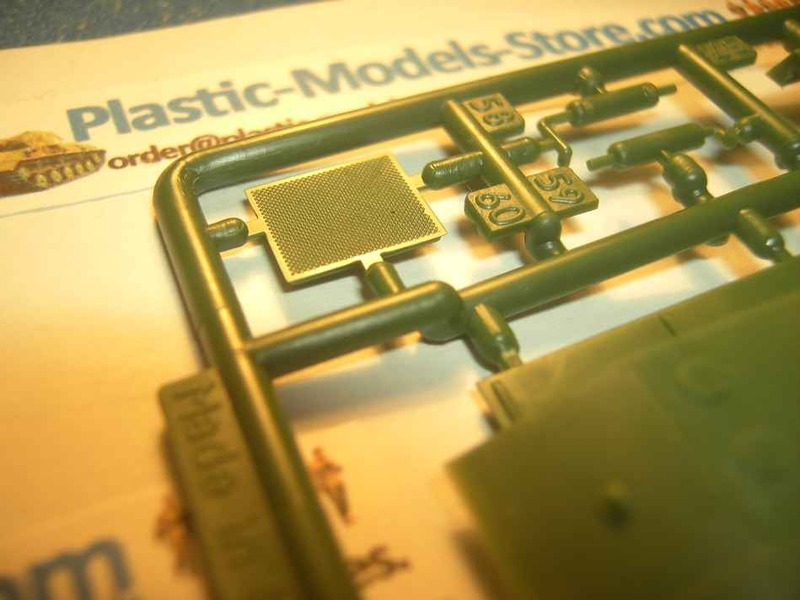 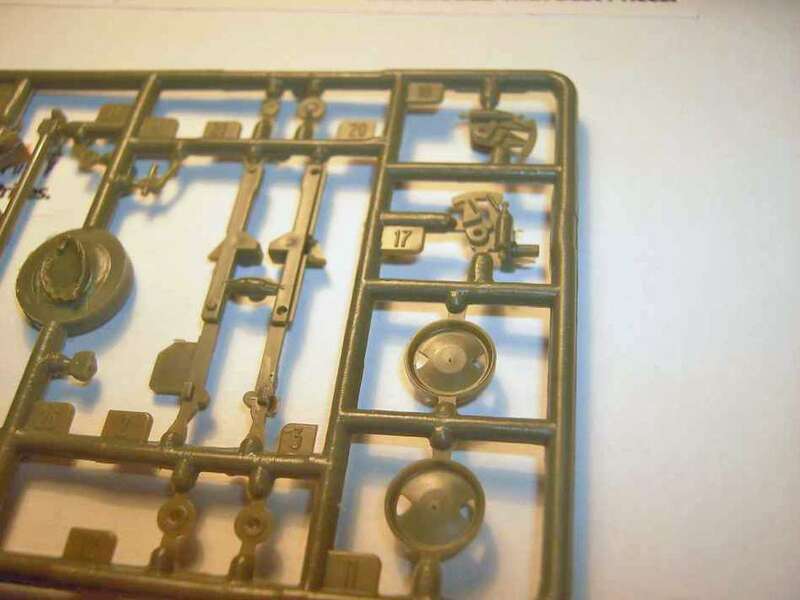 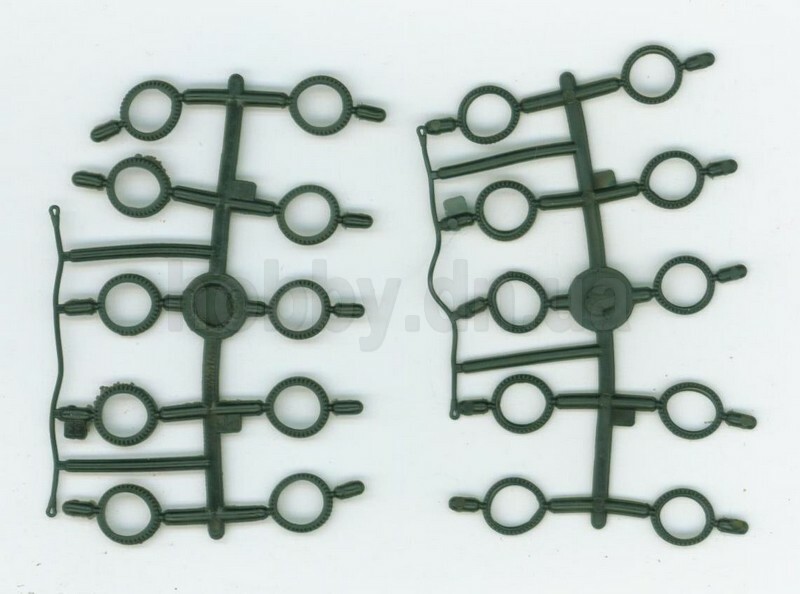 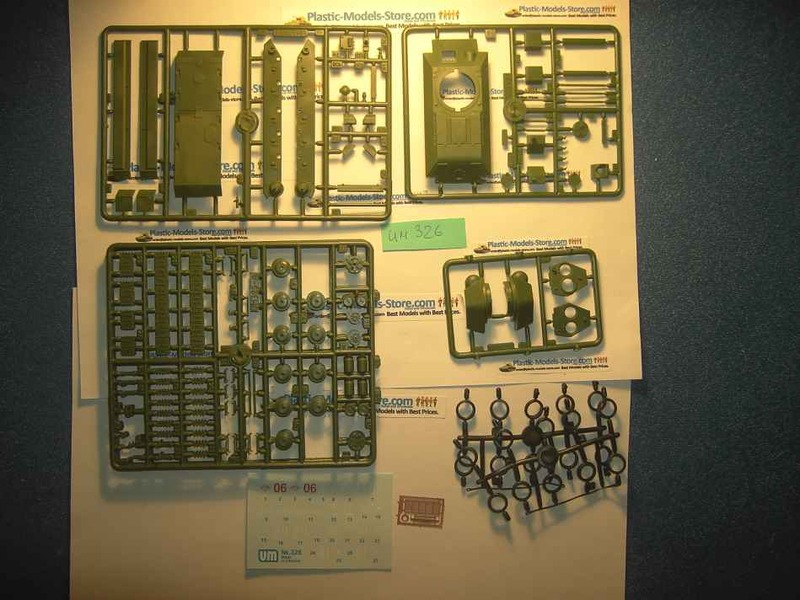 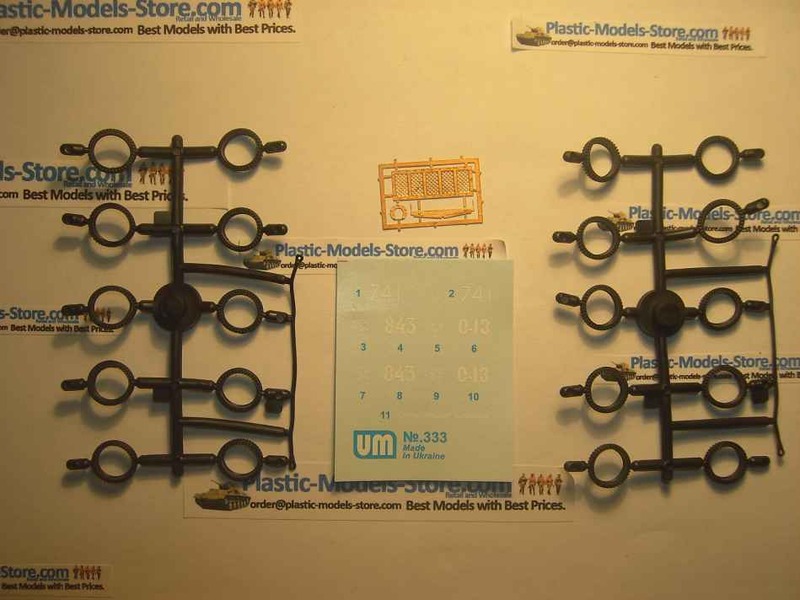 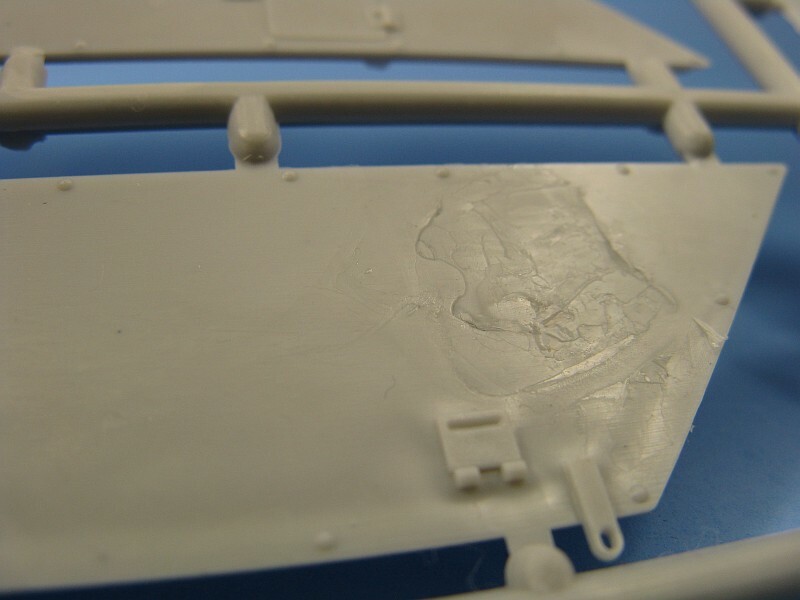 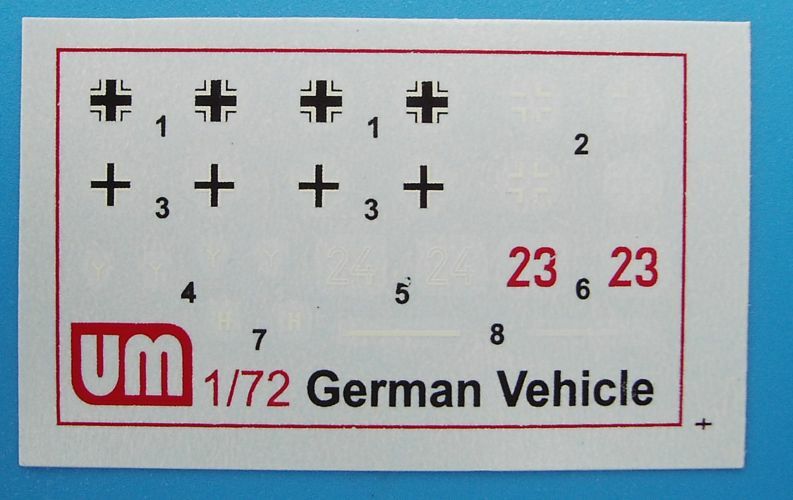 In all there are 150 crisp, clean injection moulded parts with nice raised detail, a small photo etched fret and a set of decals with markings for four vehicles (all 1944). 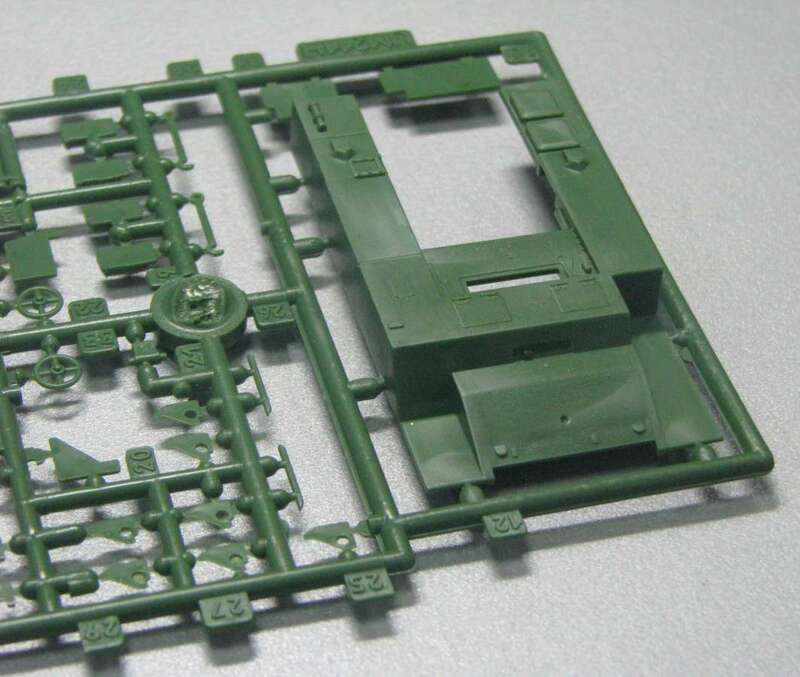 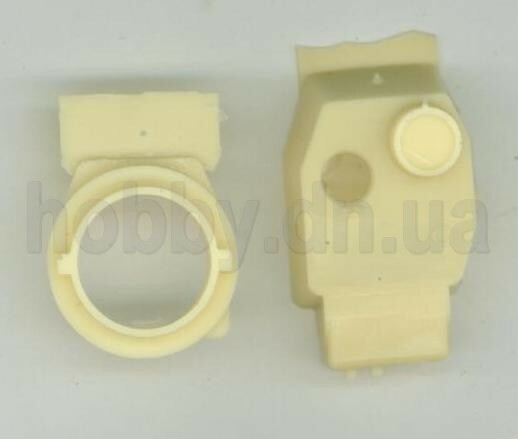 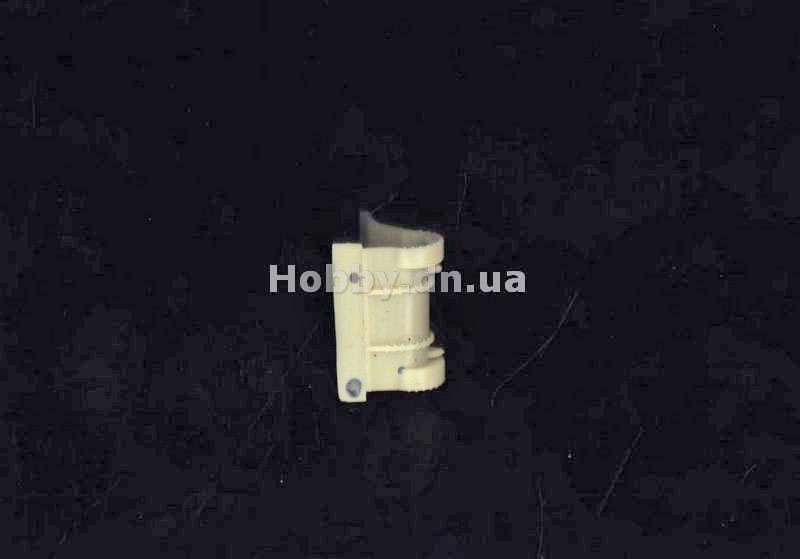 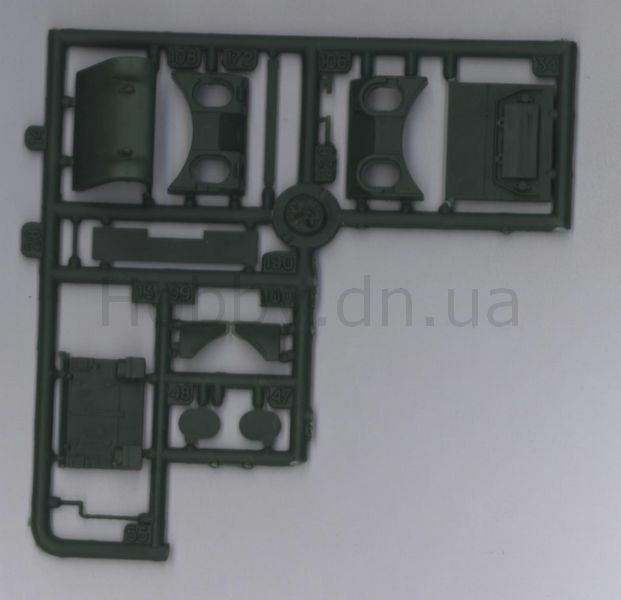 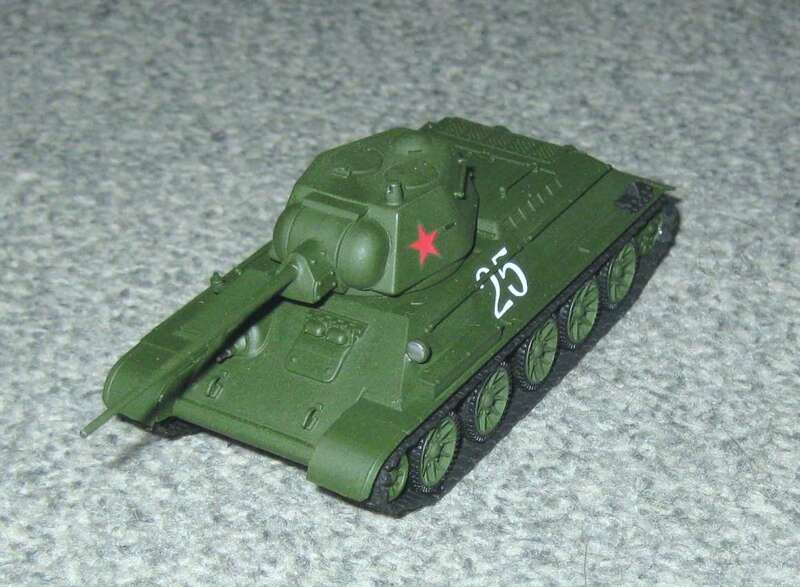 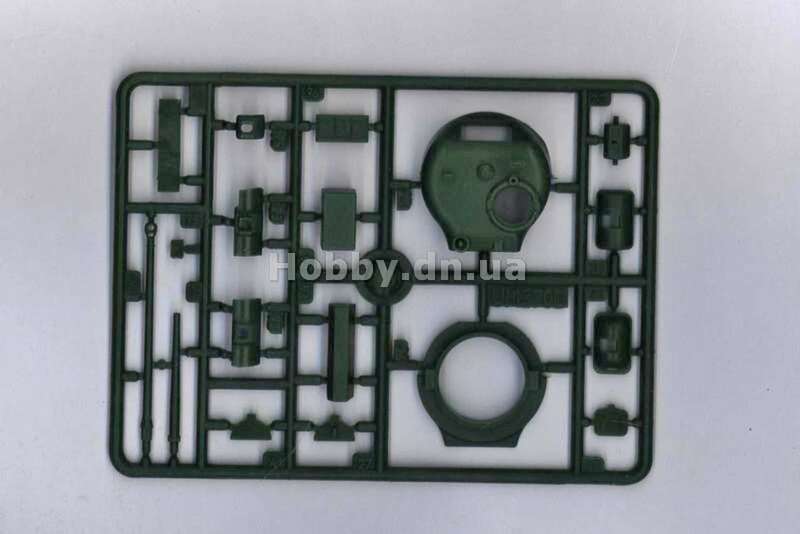 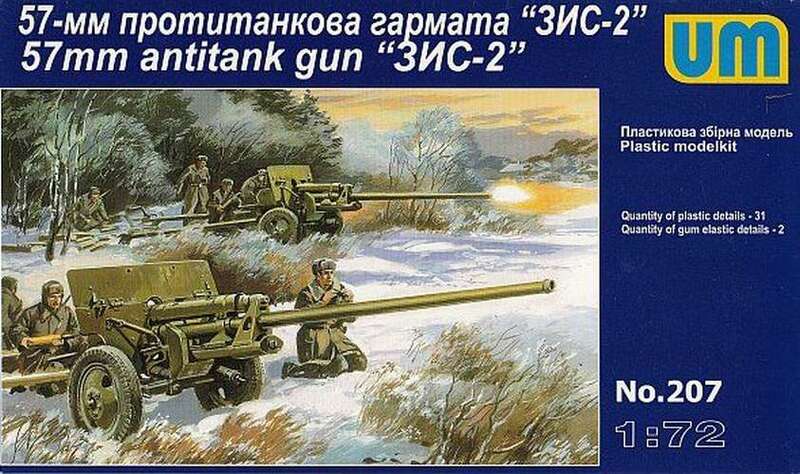 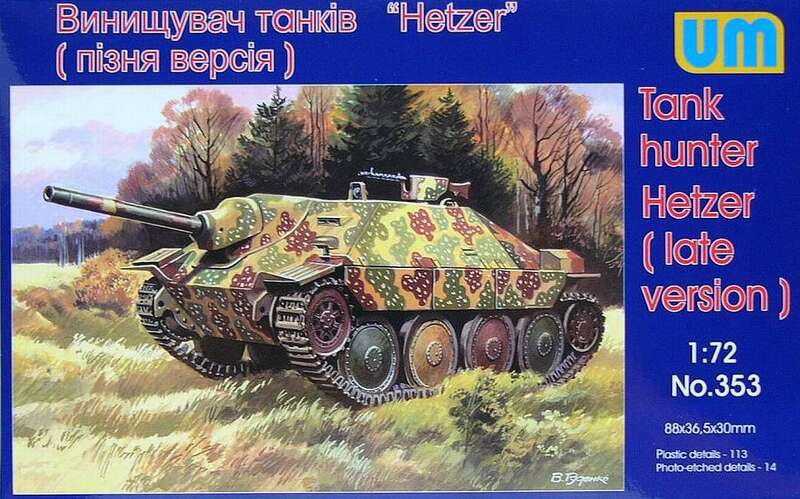 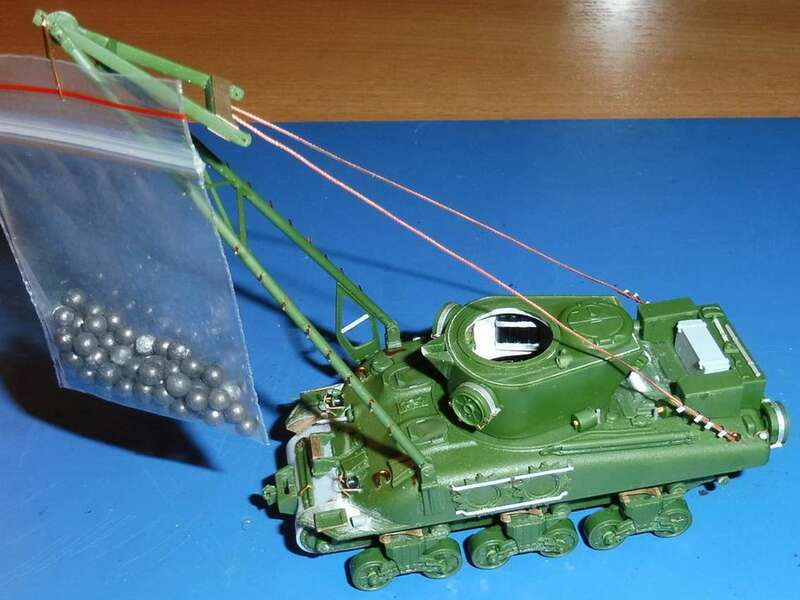 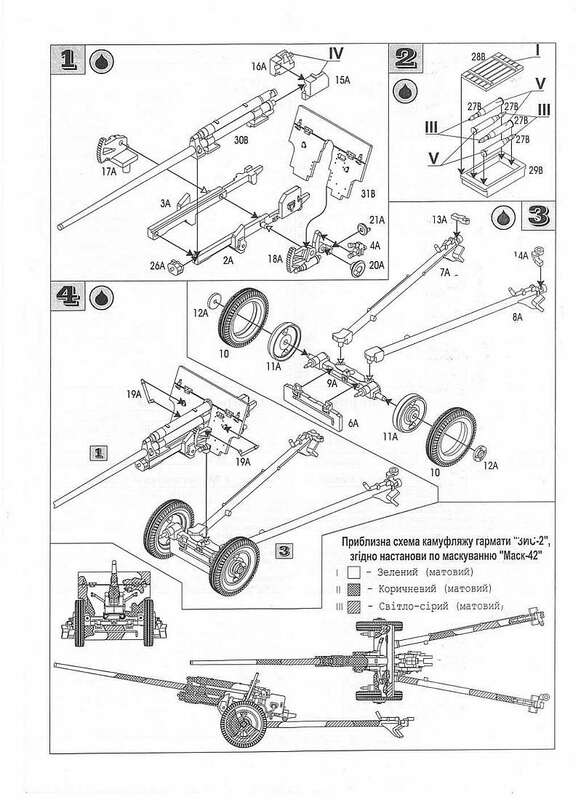 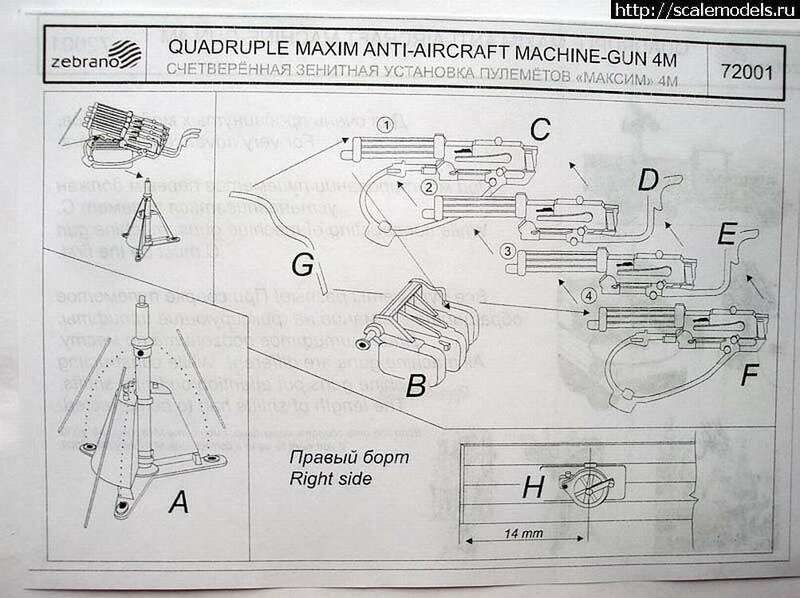 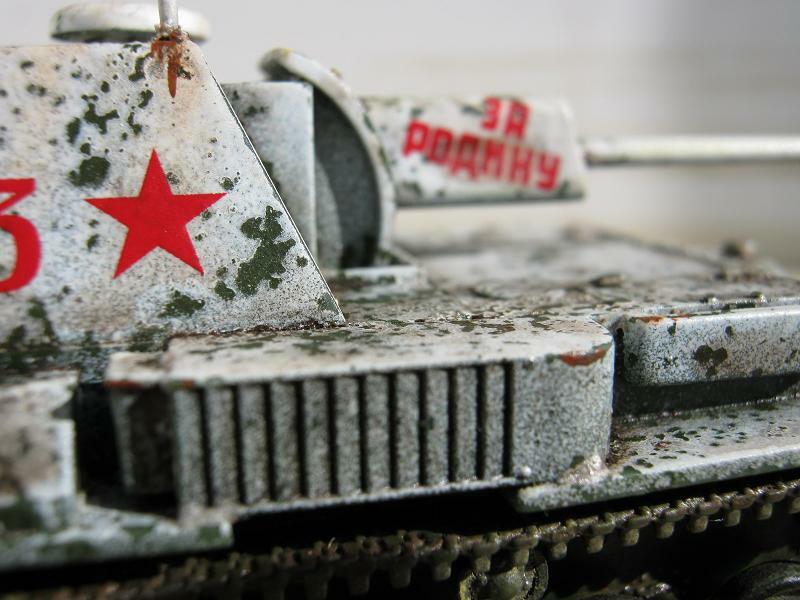 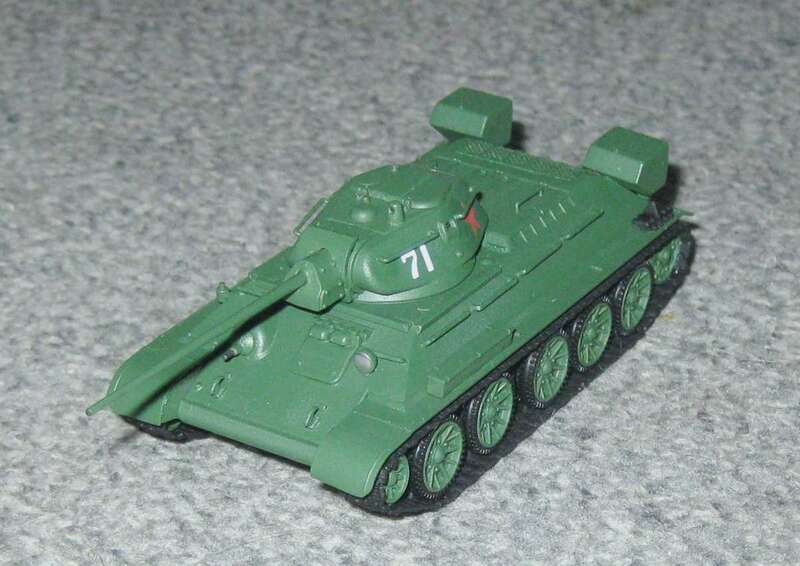 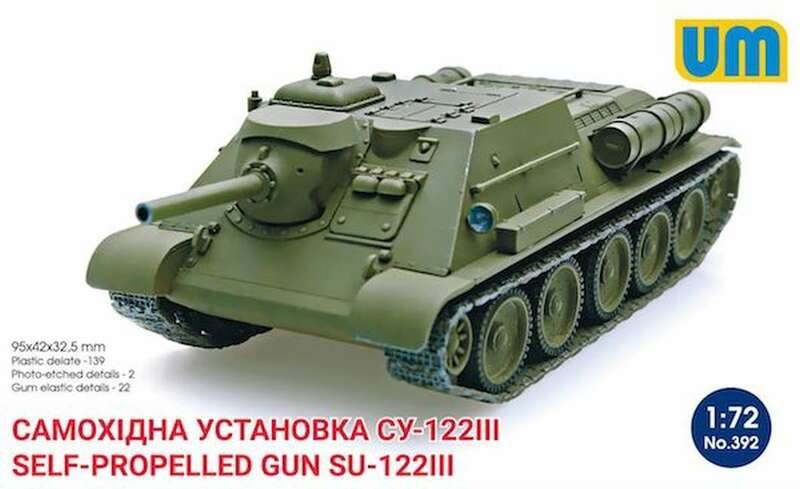 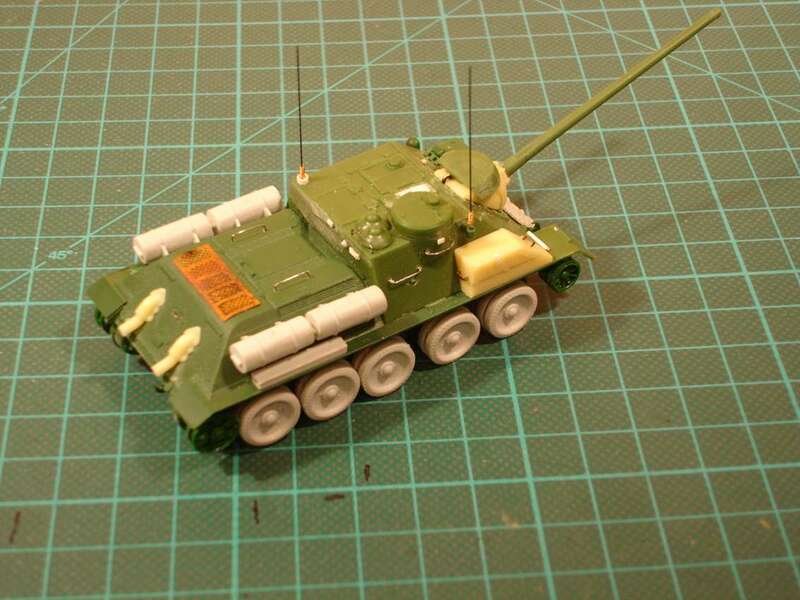 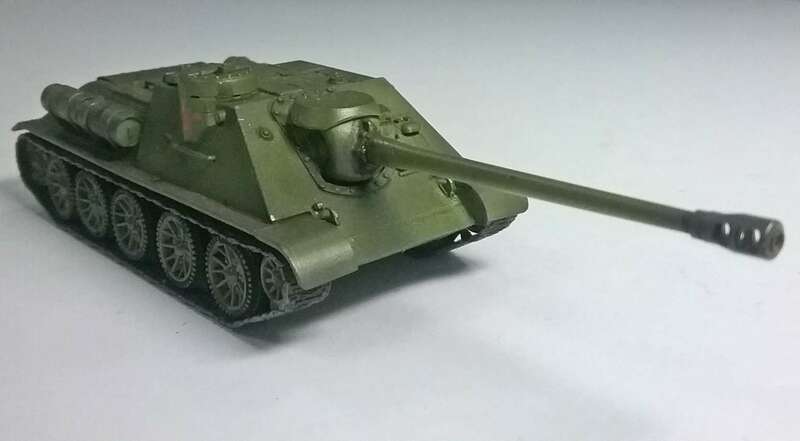 A dozen or so parts make this versionslightly different from the ZSU-37 1943, released a while ago. 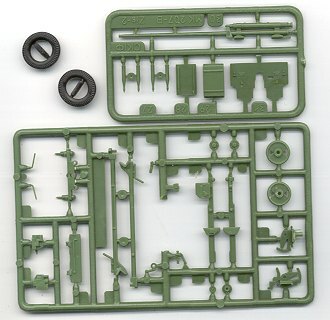 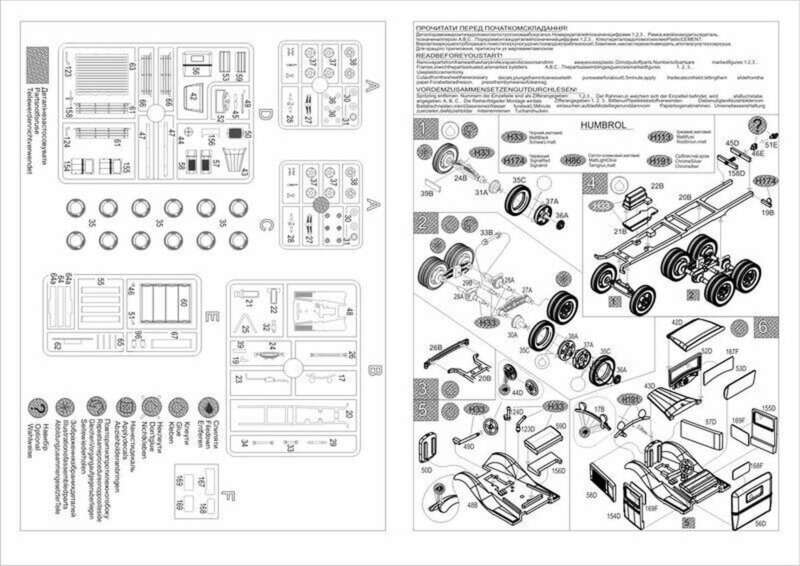 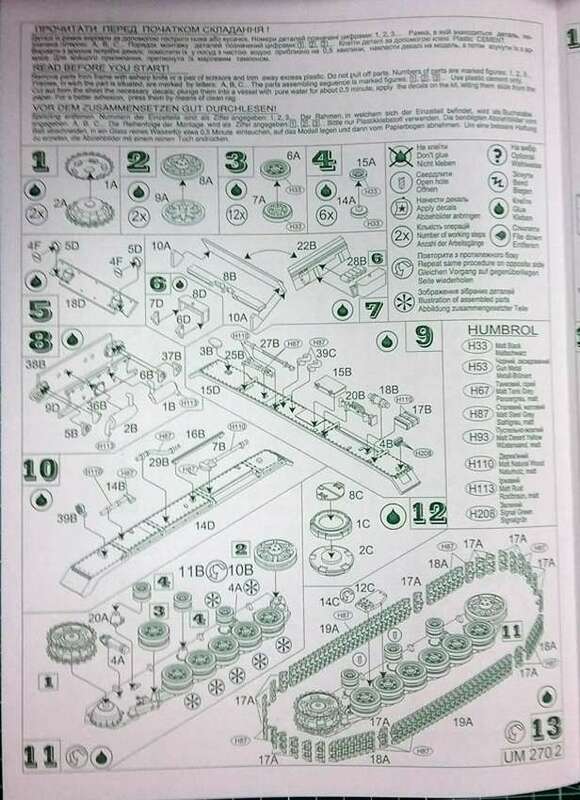 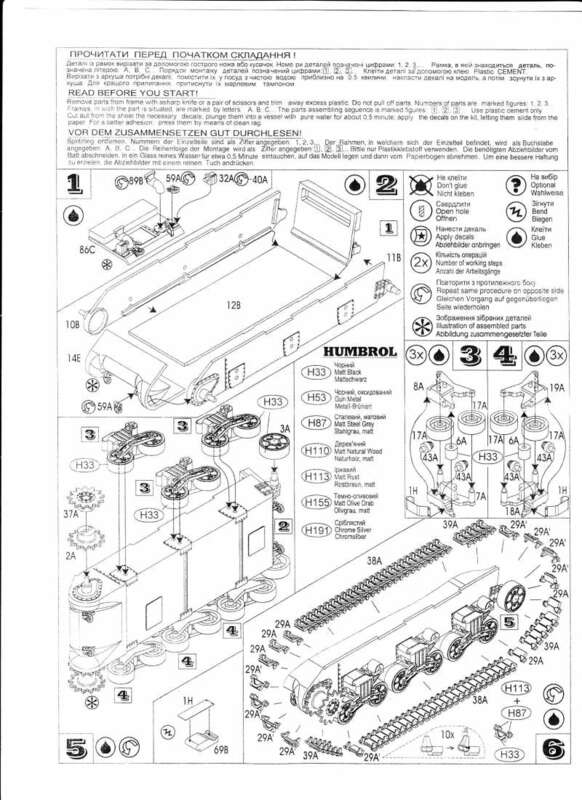 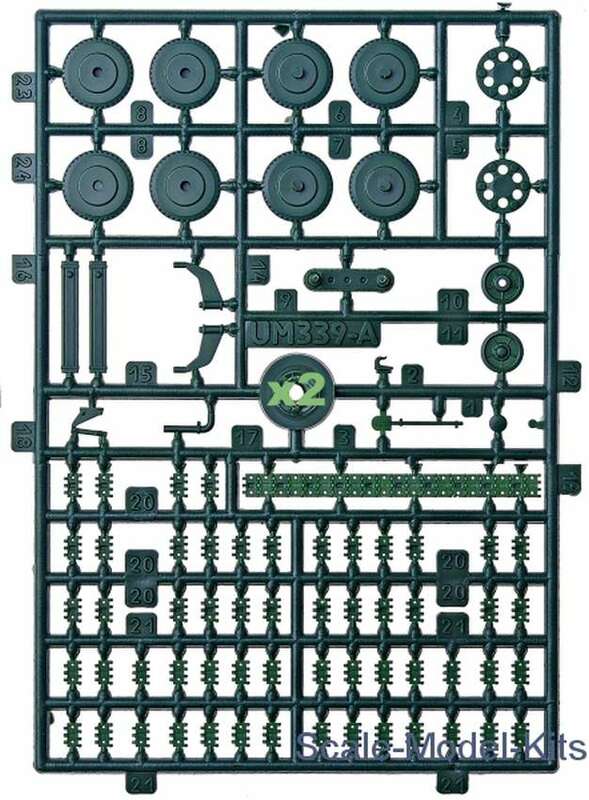 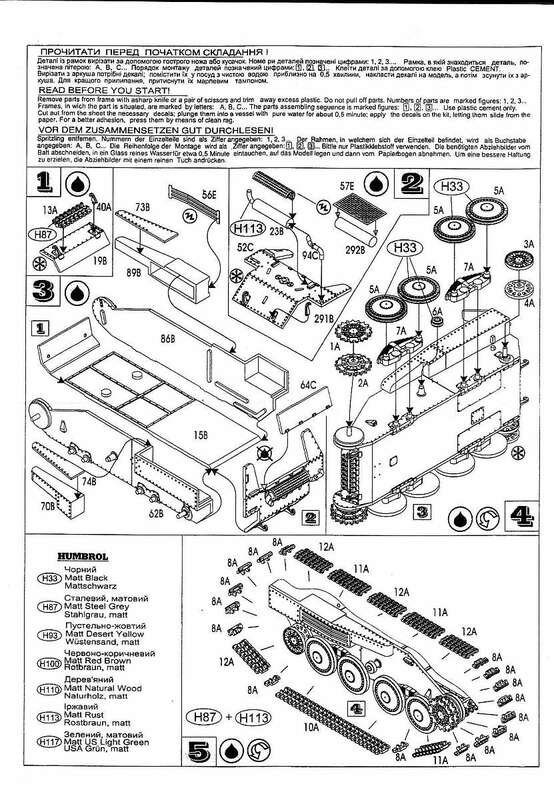 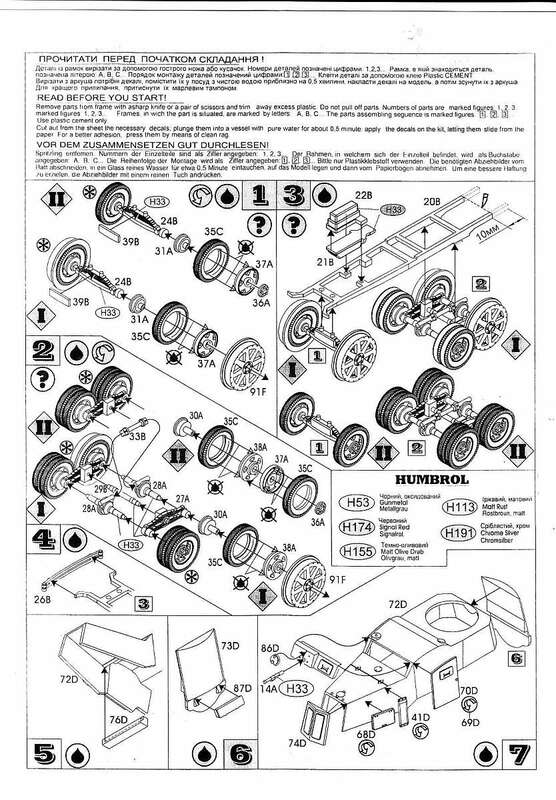 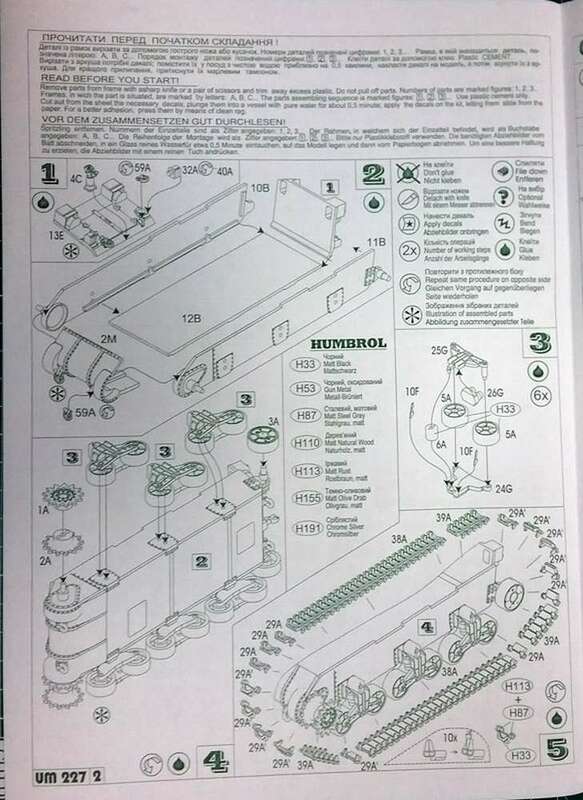 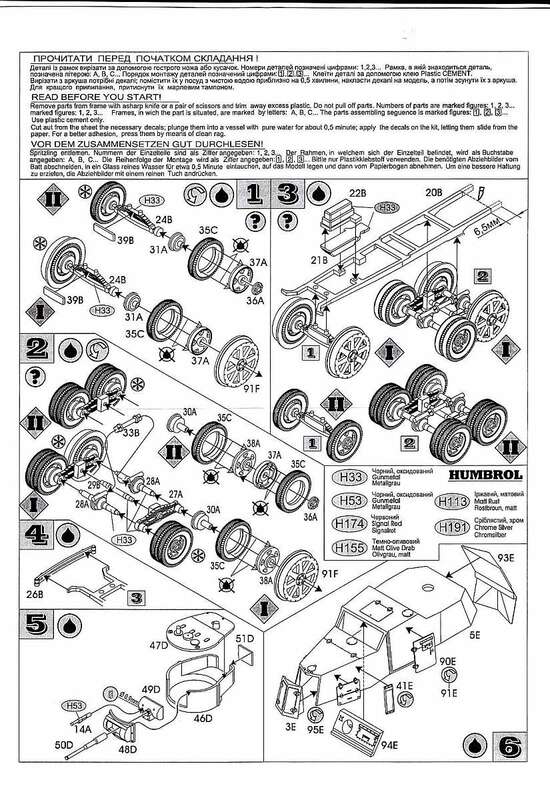 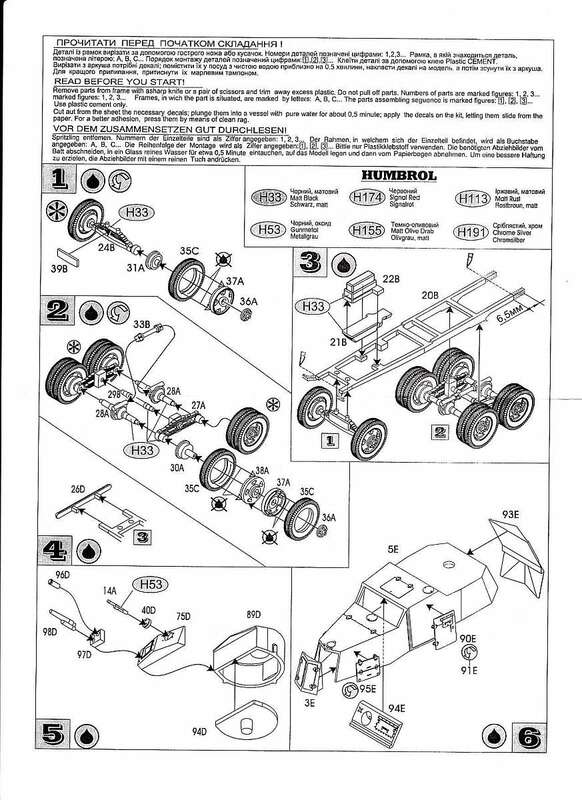 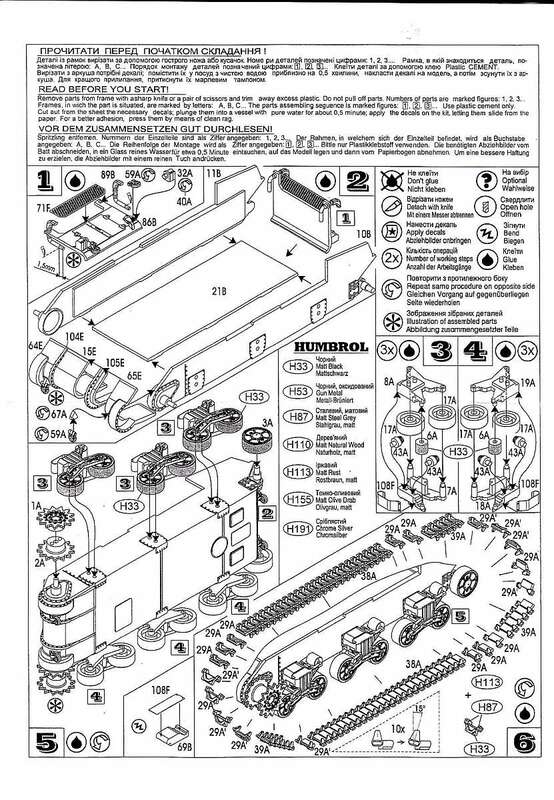 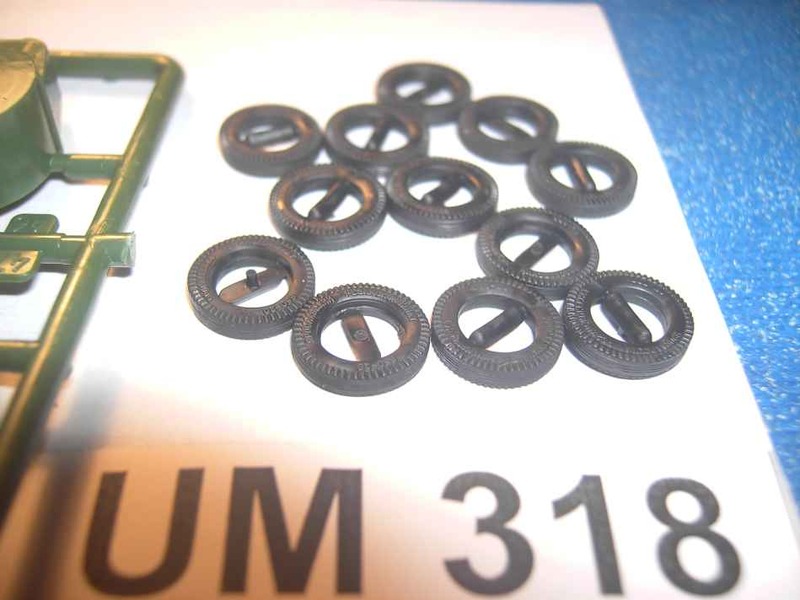 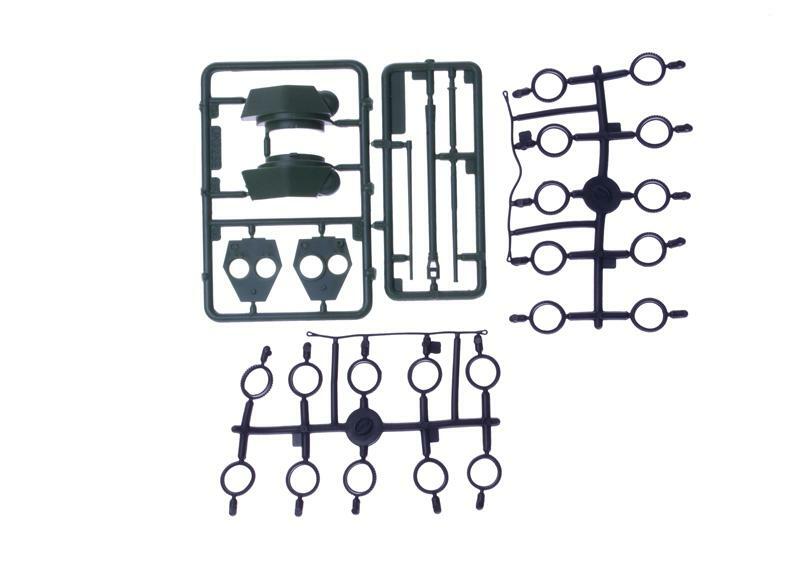 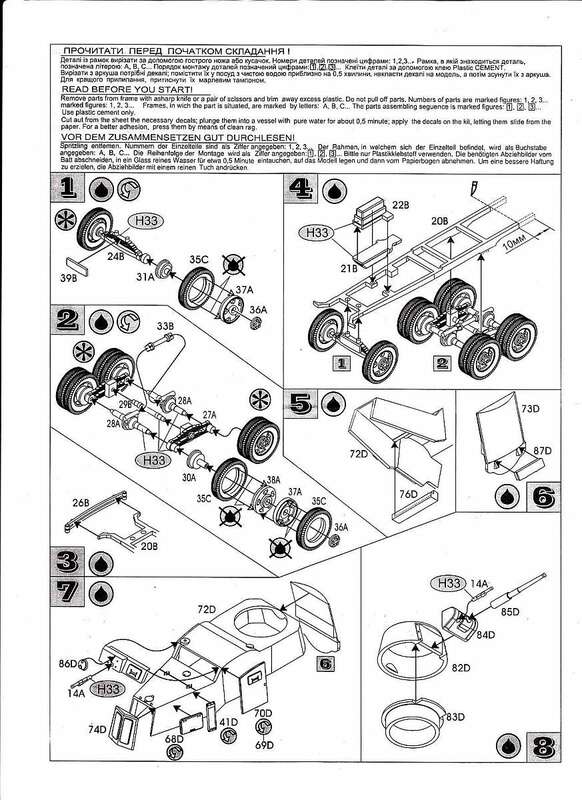 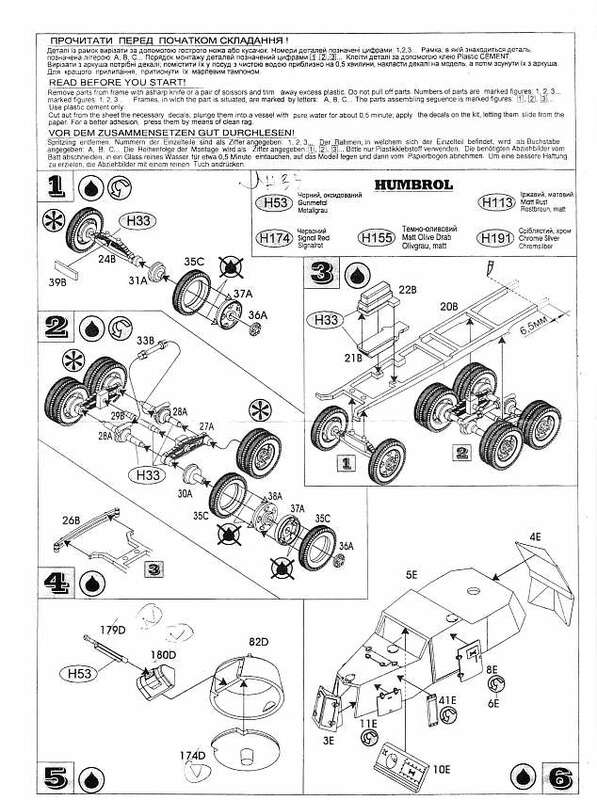 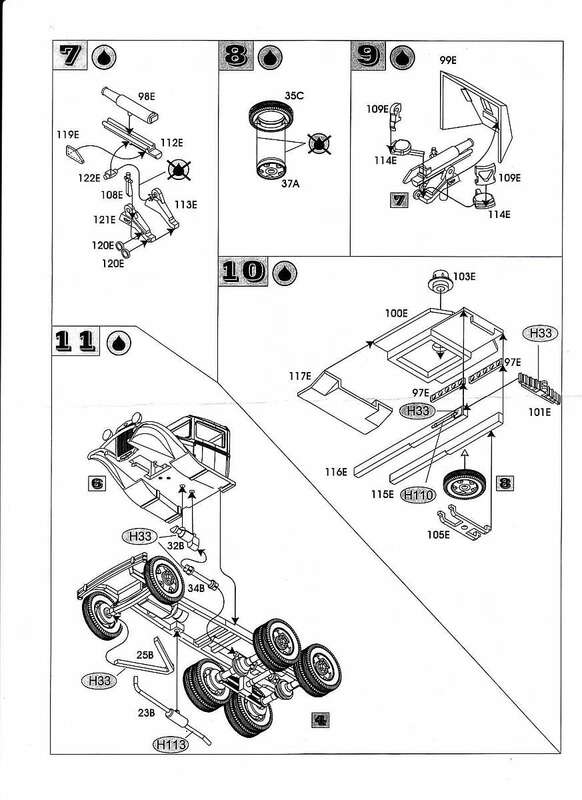 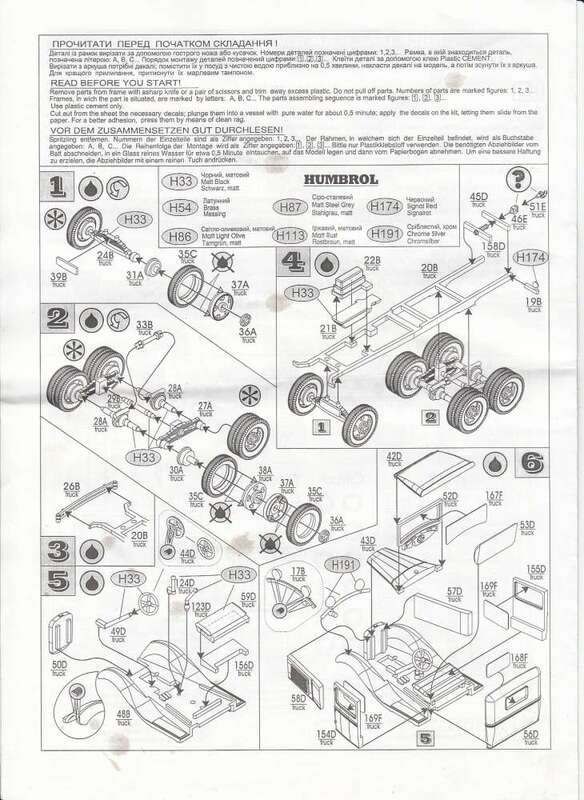 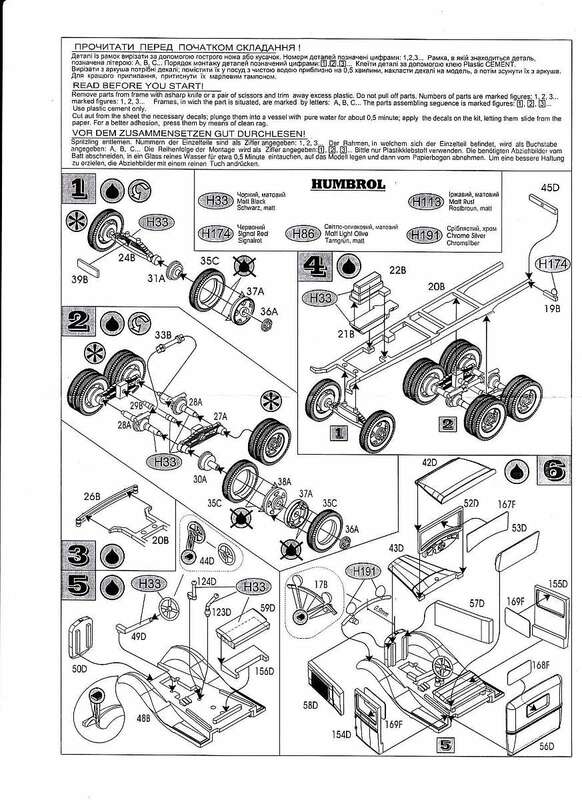 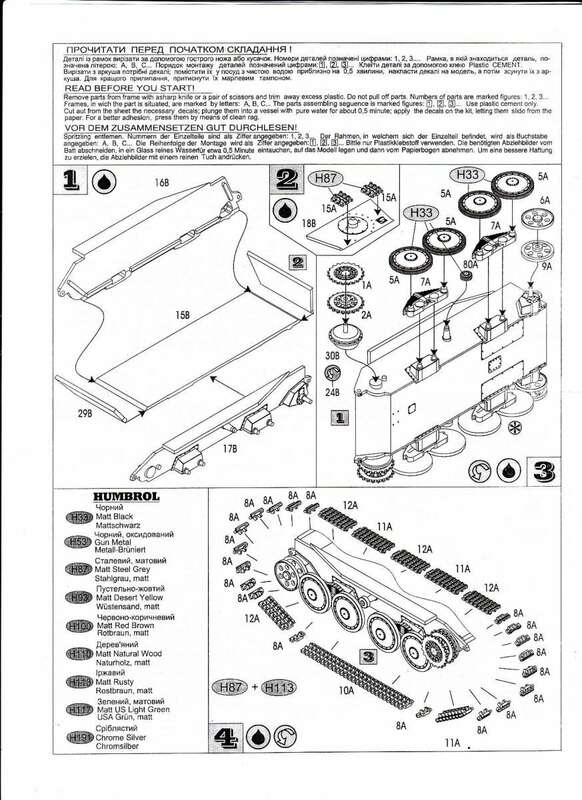 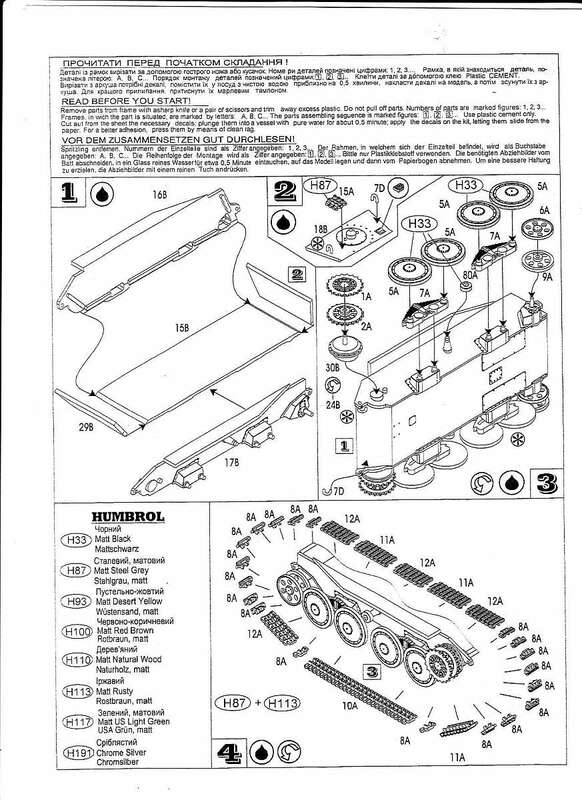 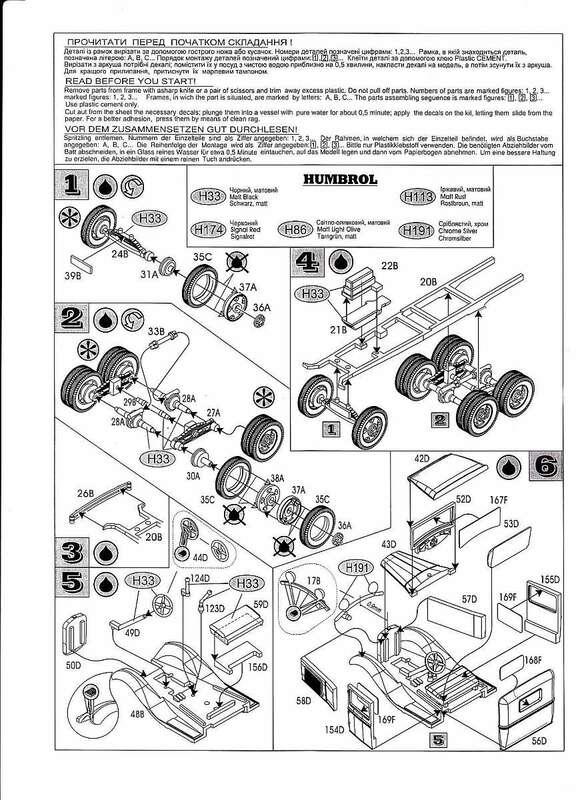 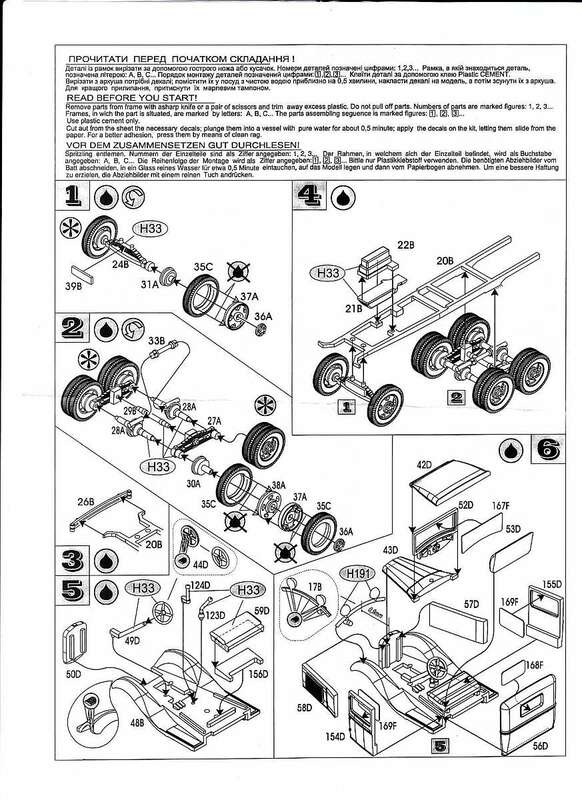 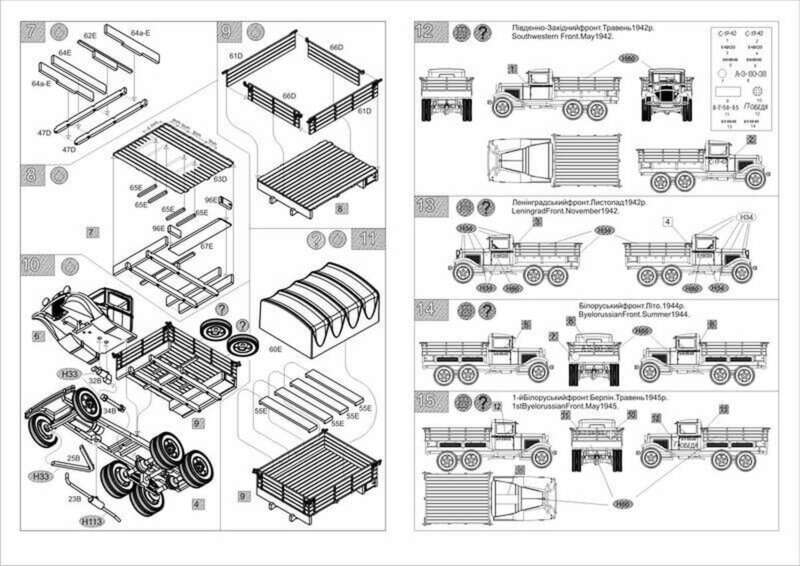 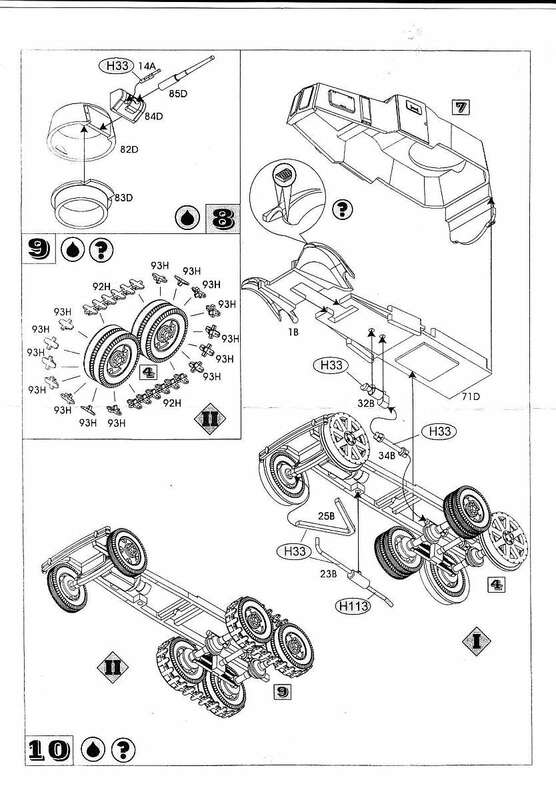 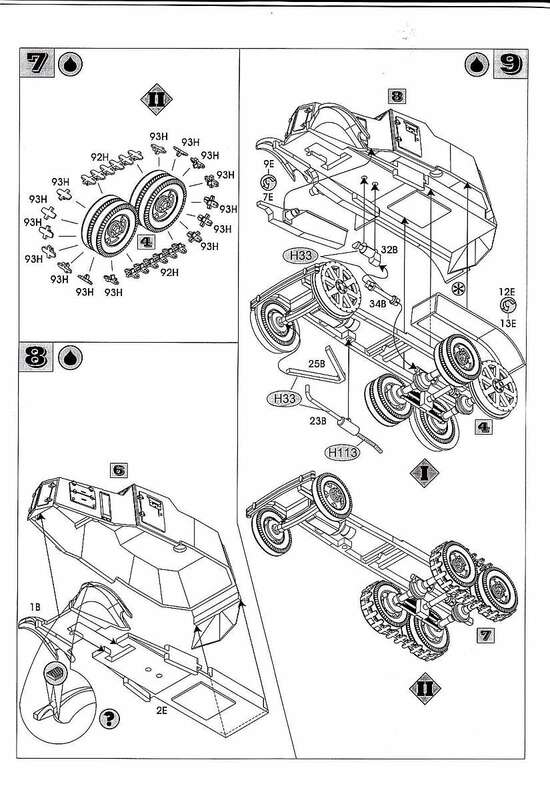 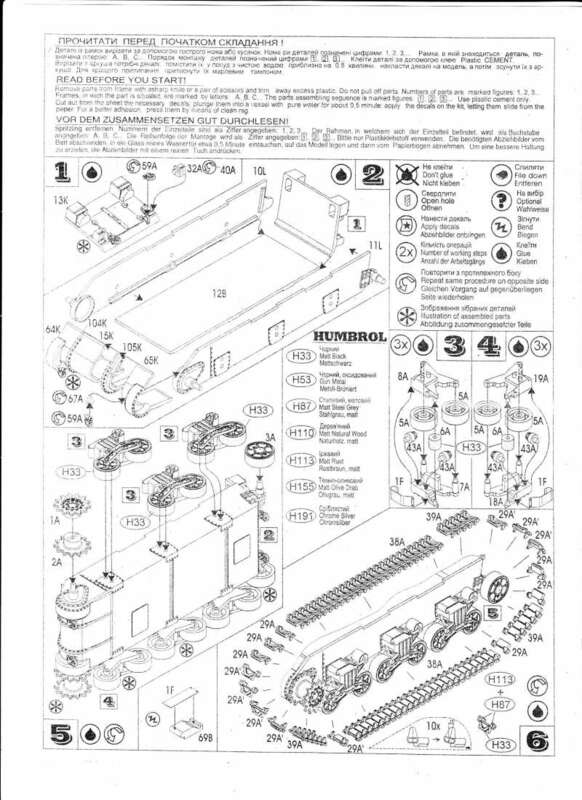 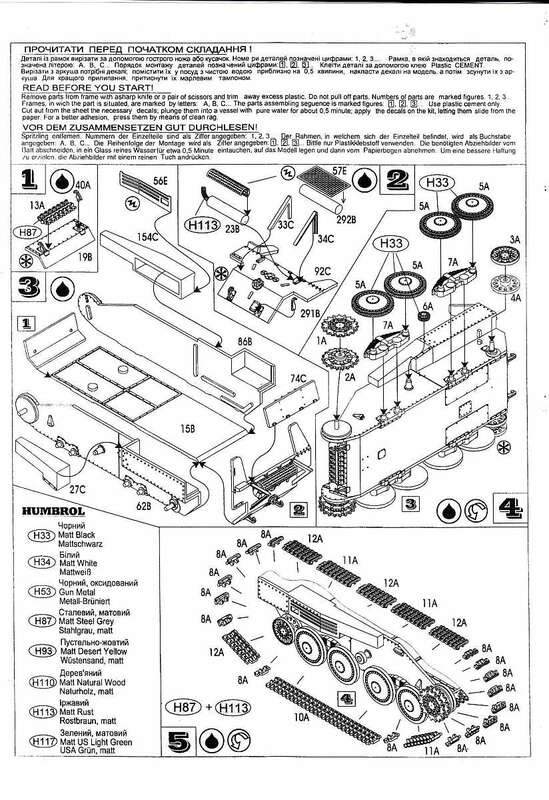 You now get 129 crisp, clean, injection moulded parts (with good raised detail)...including 'link and length' tracks, separate road wheels and suspension arms. 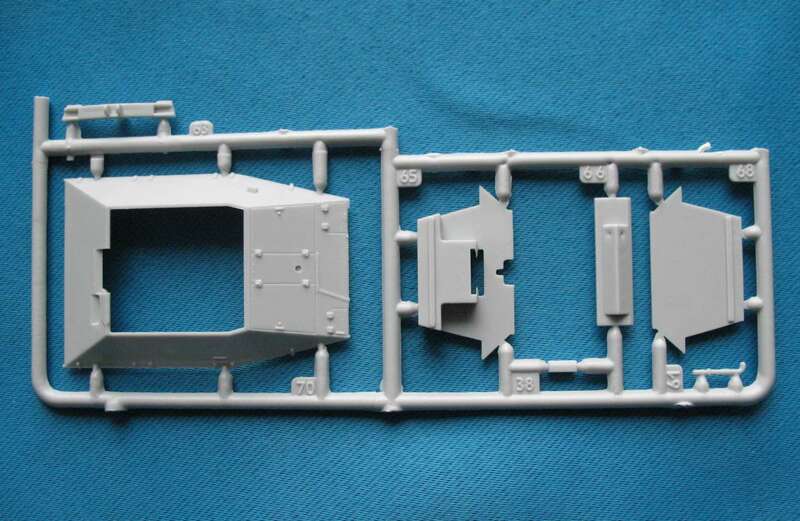 The 'open' gun turret is fully detailed and there's an optional position driver's compartment hatch. 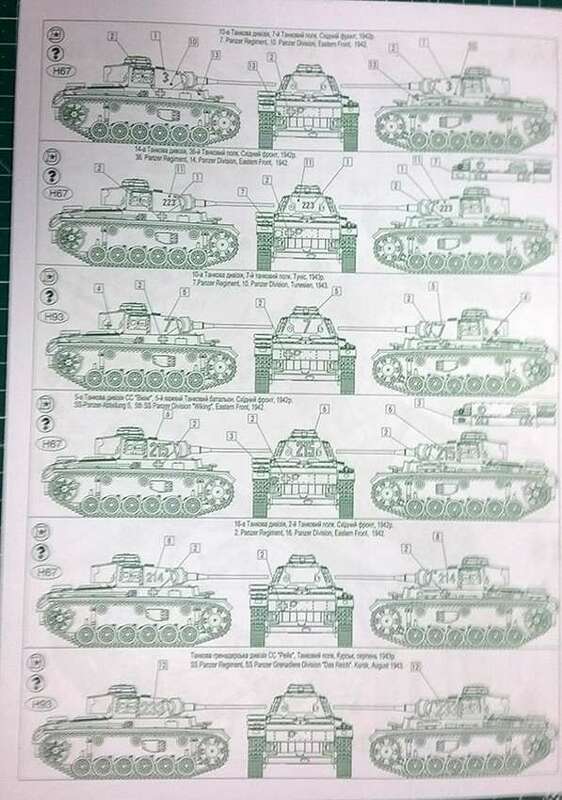 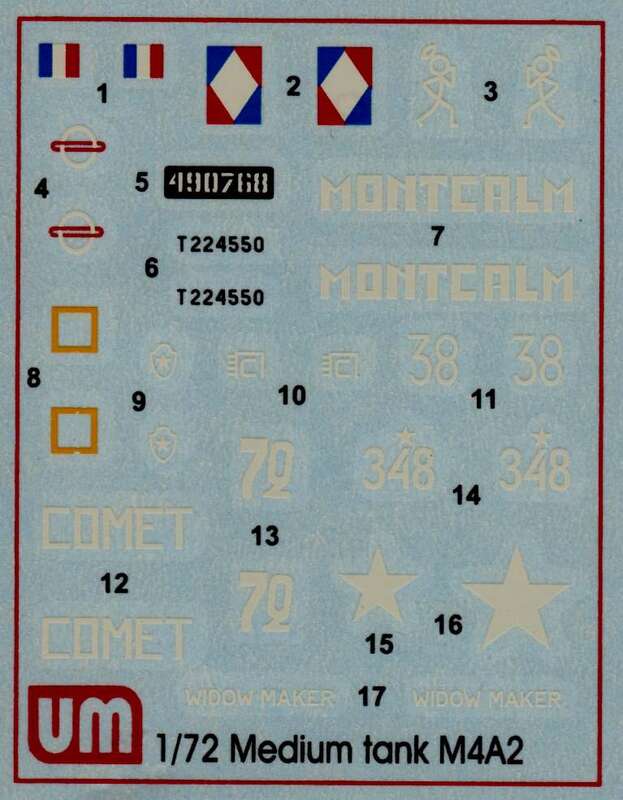 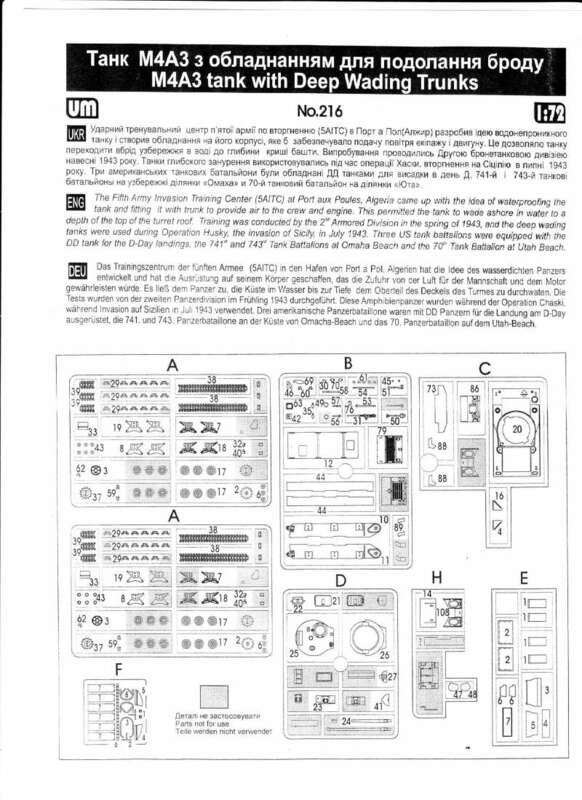 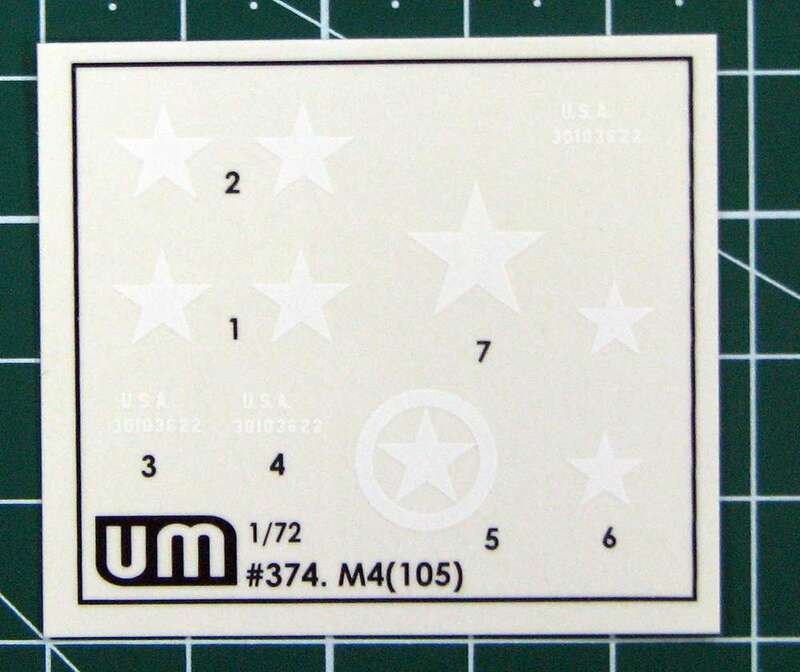 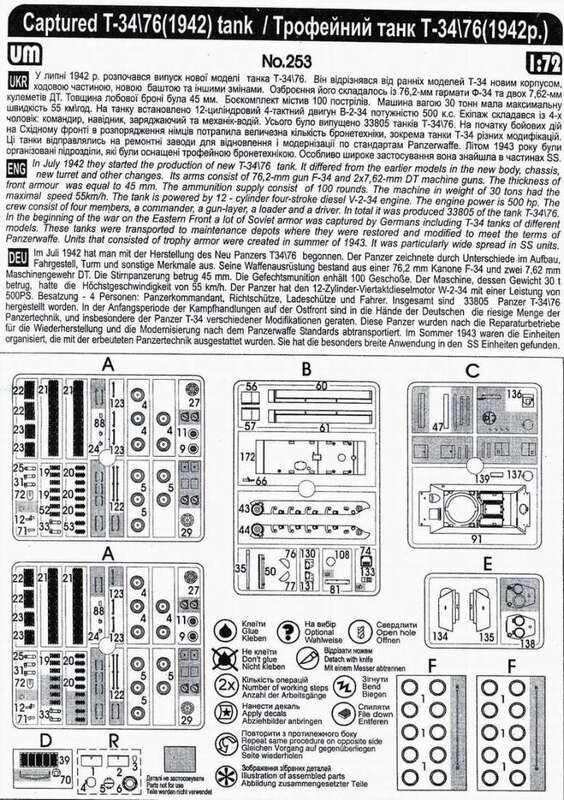 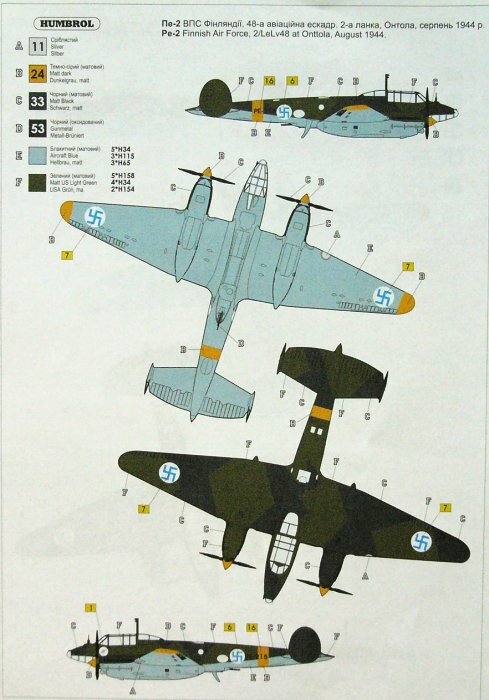 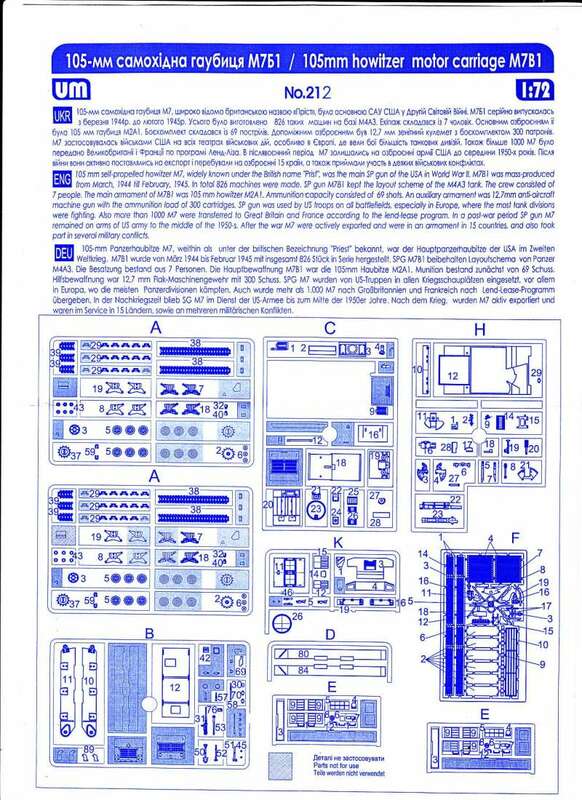 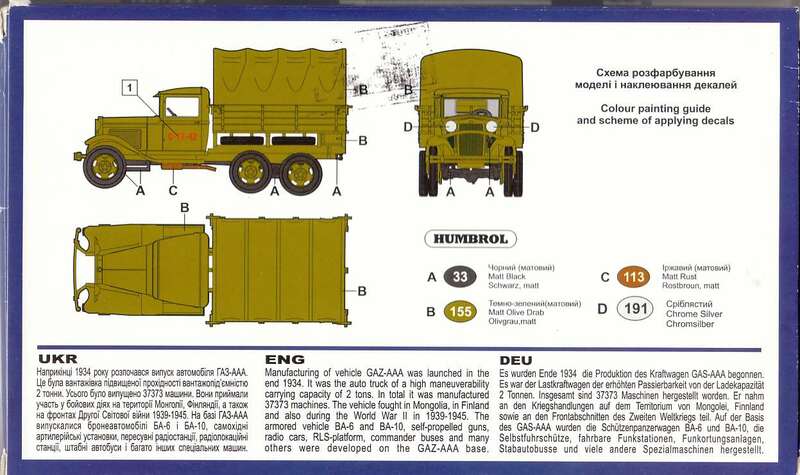 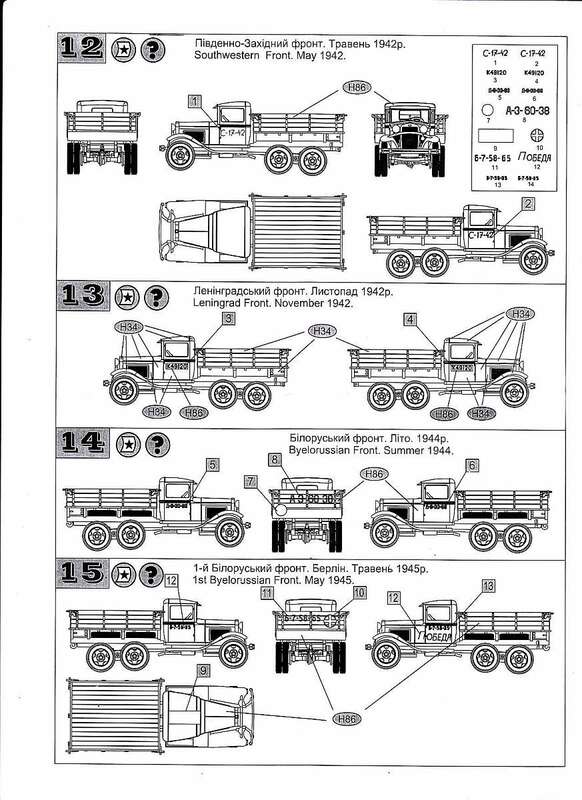 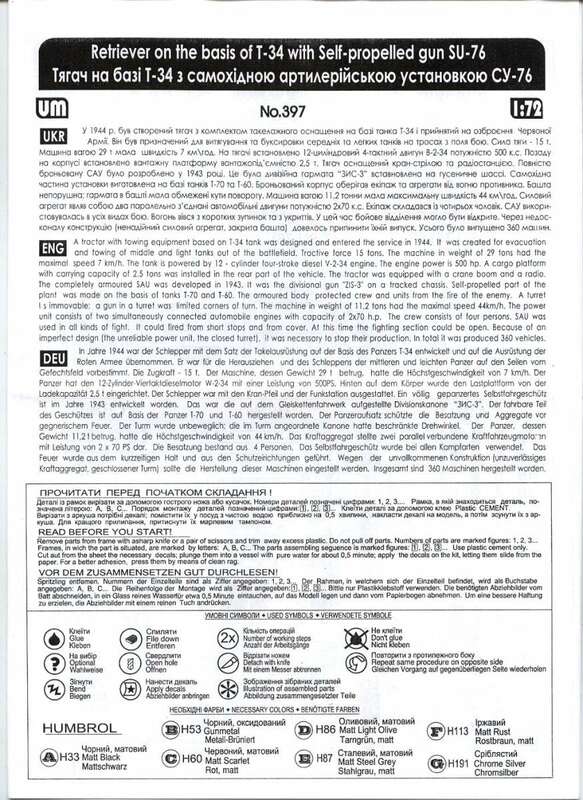 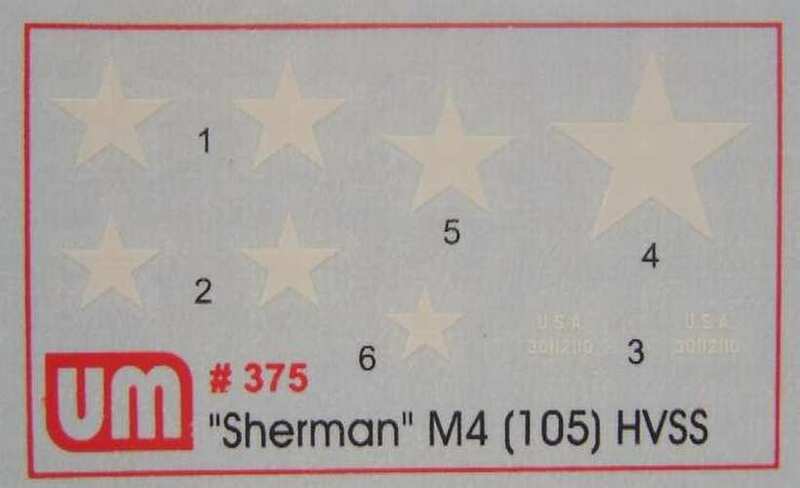 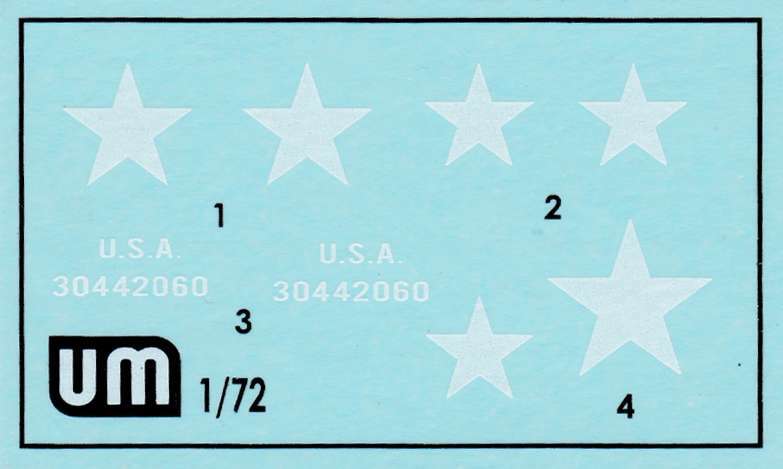 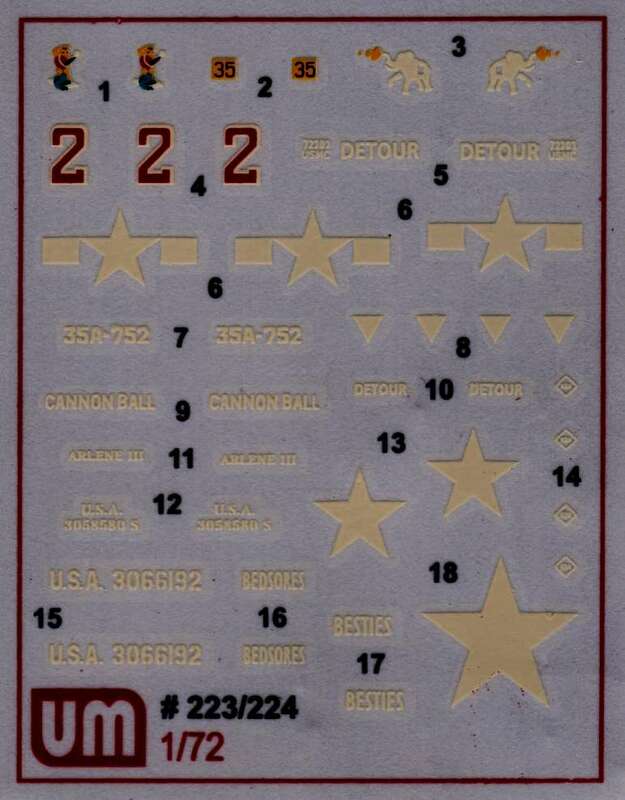 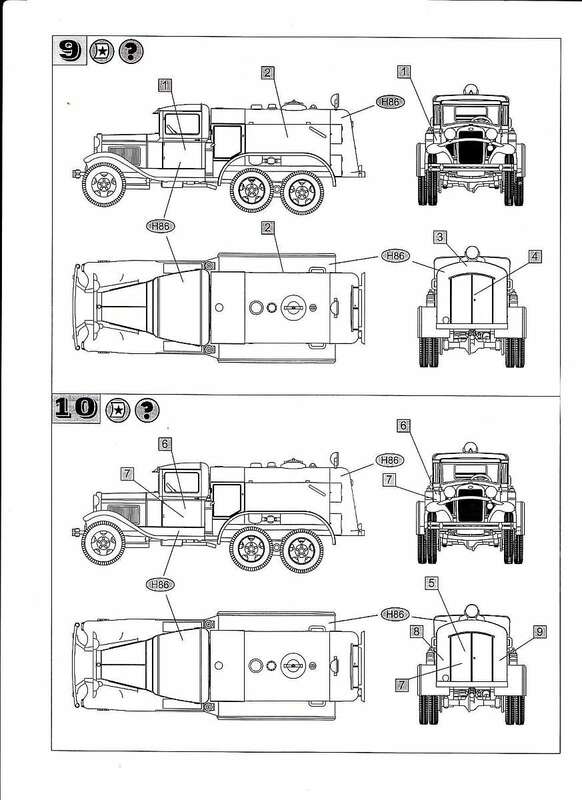 The decal sheet has markings for just the one vehicle. 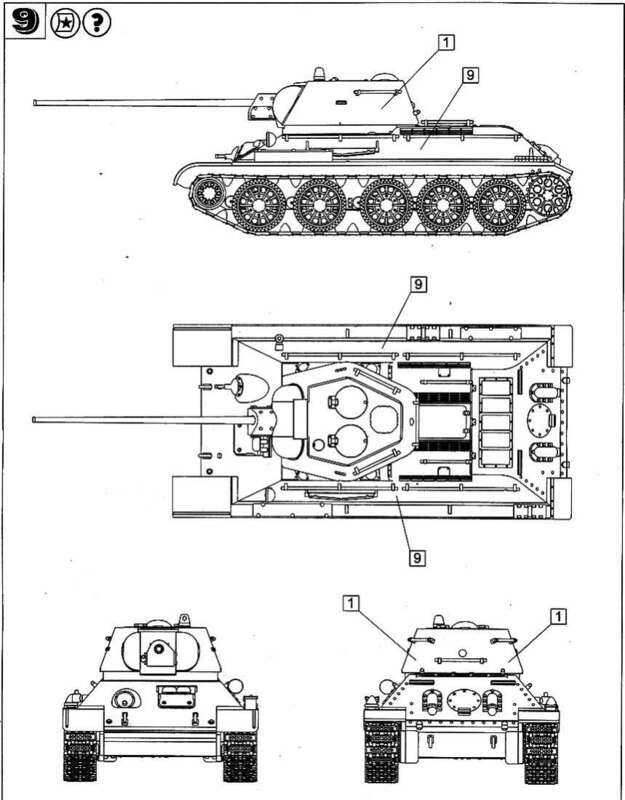 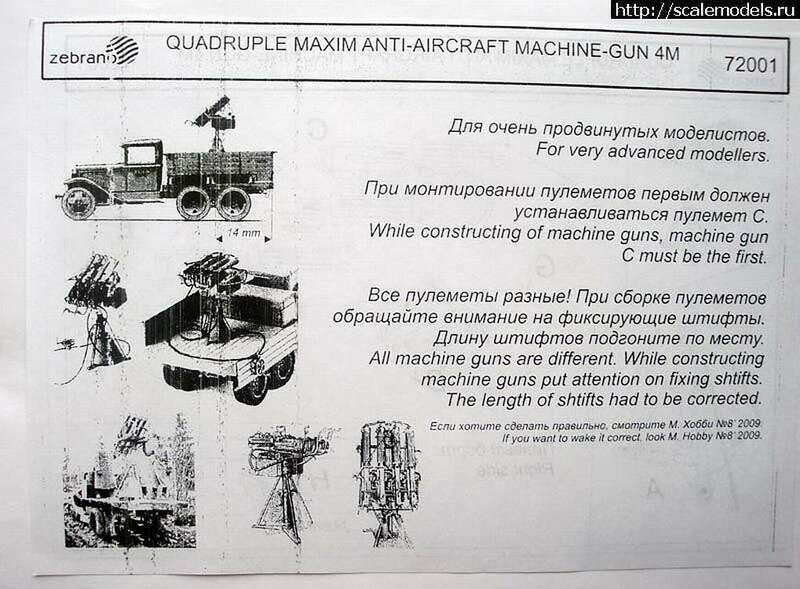 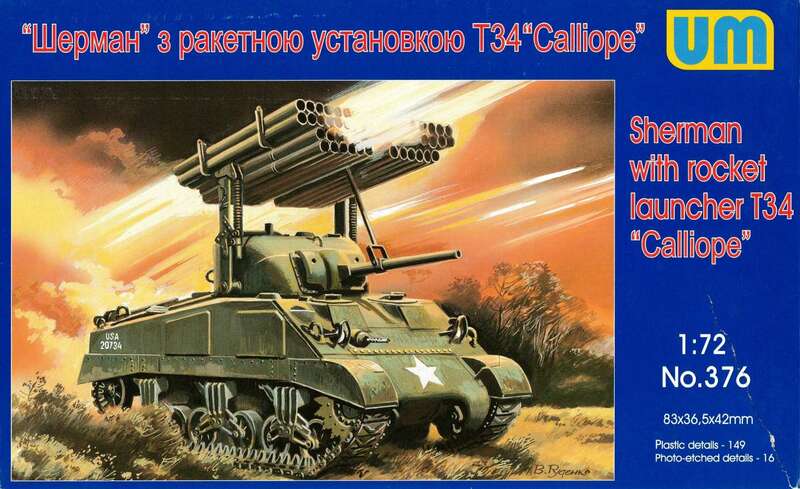 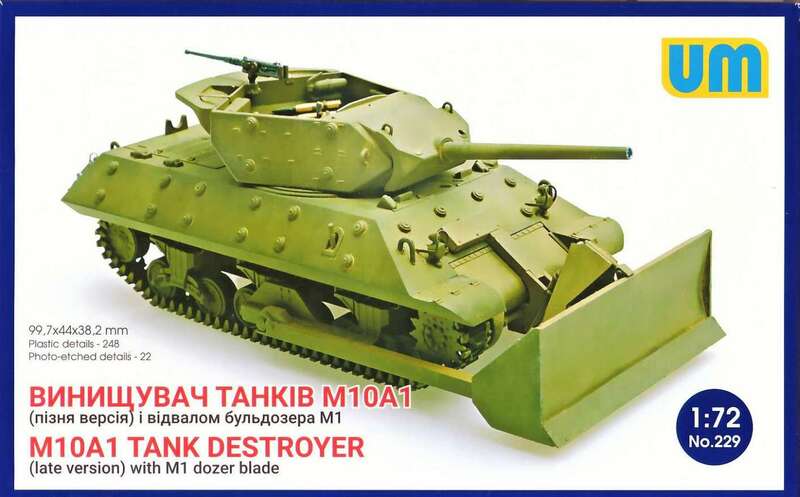 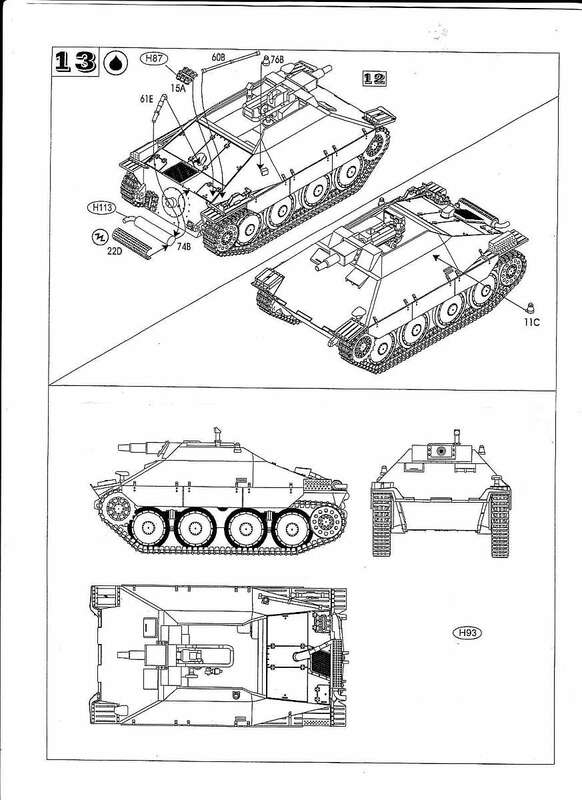 Similar to the BA-10 but not the same...a different shaped body and turret. 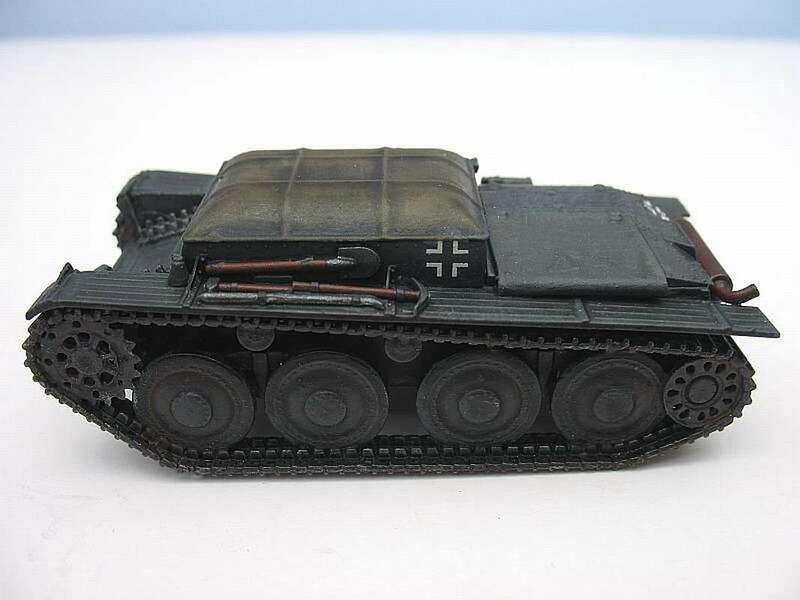 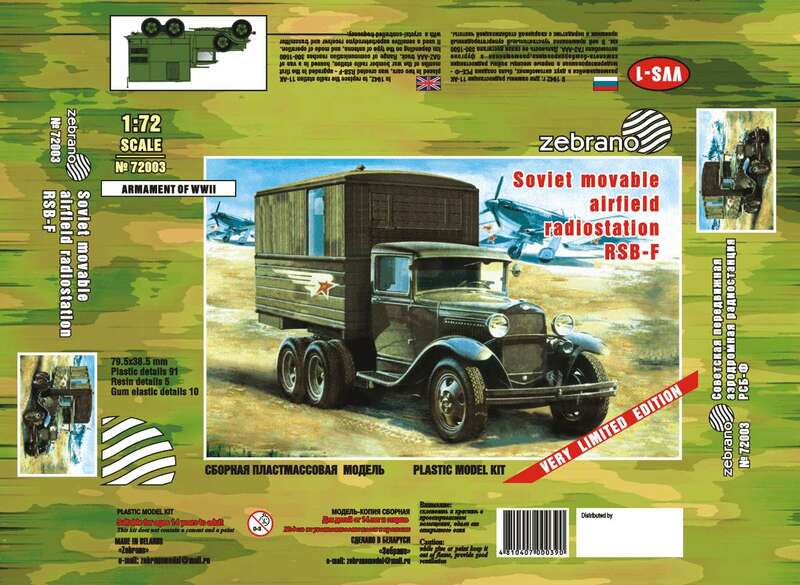 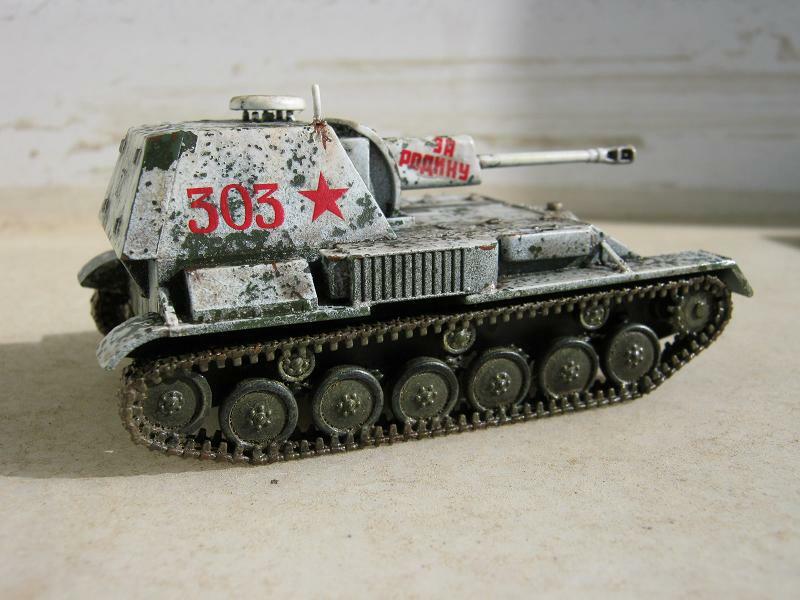 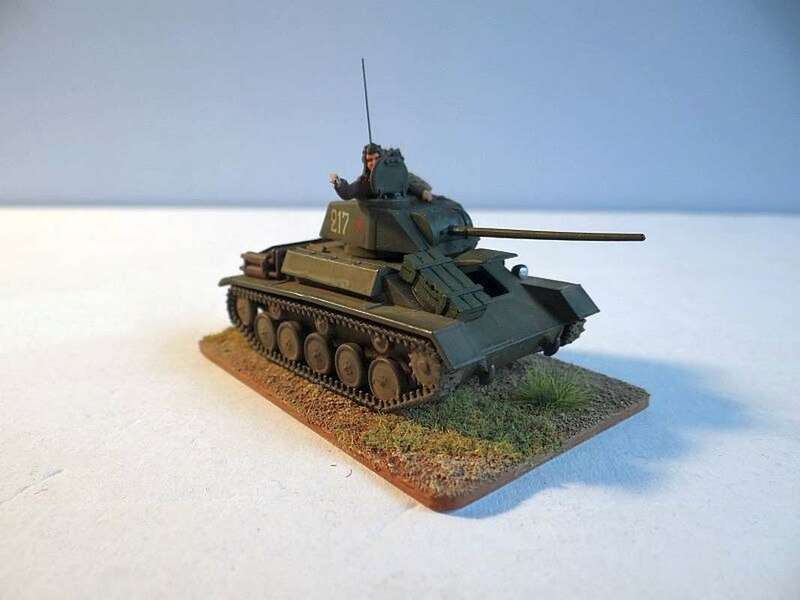 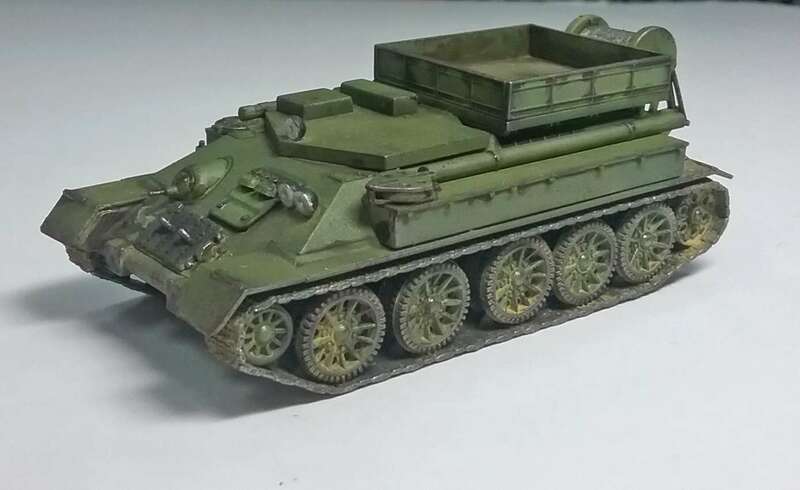 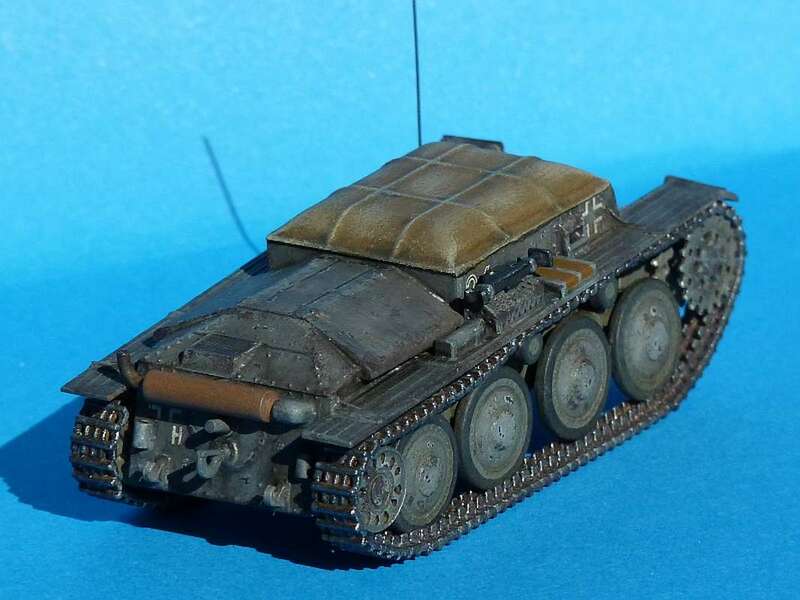 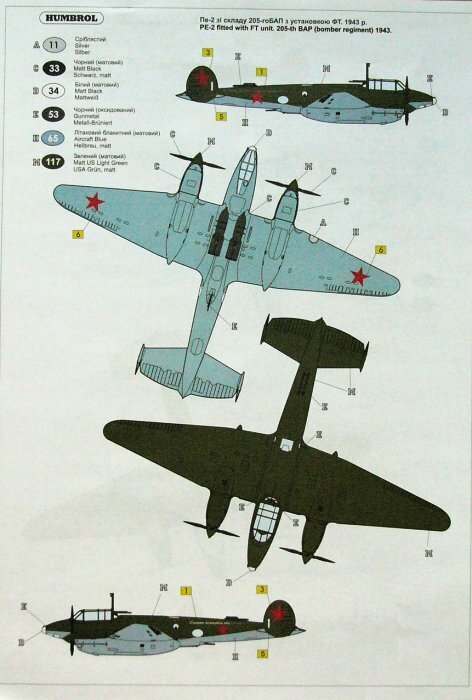 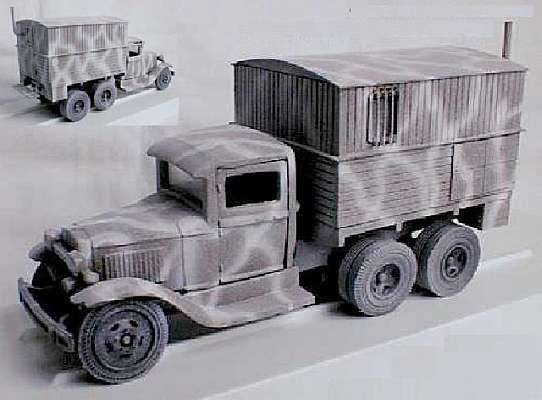 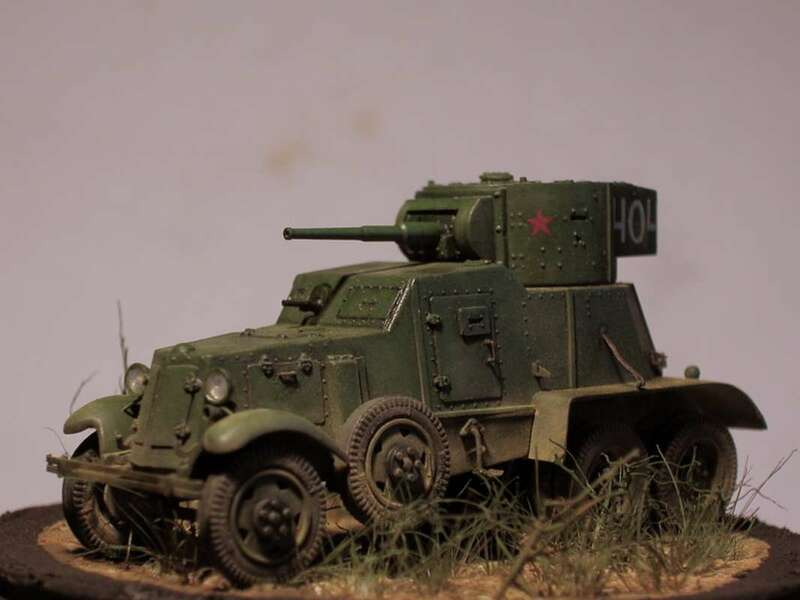 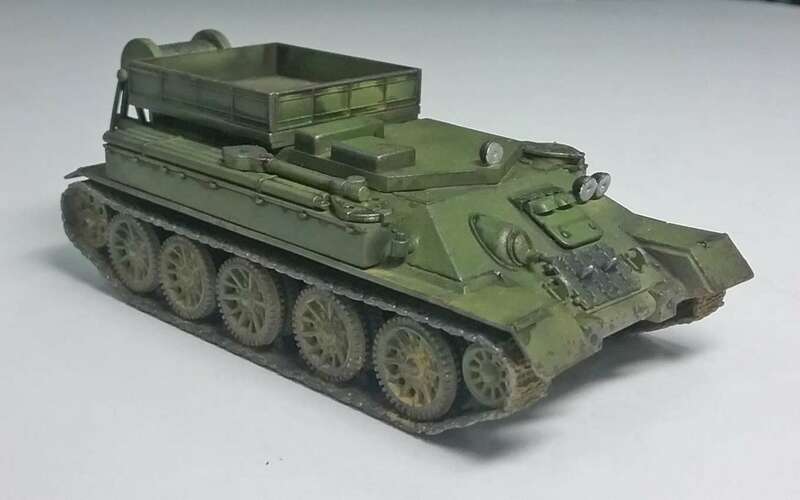 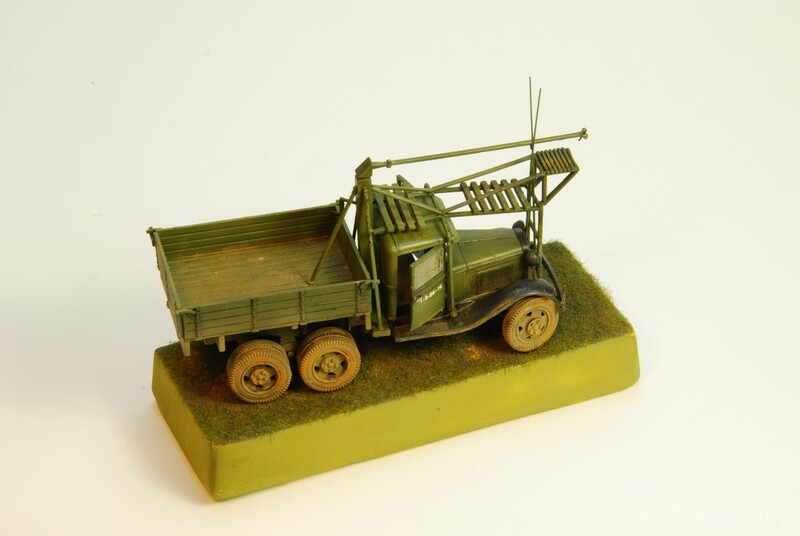 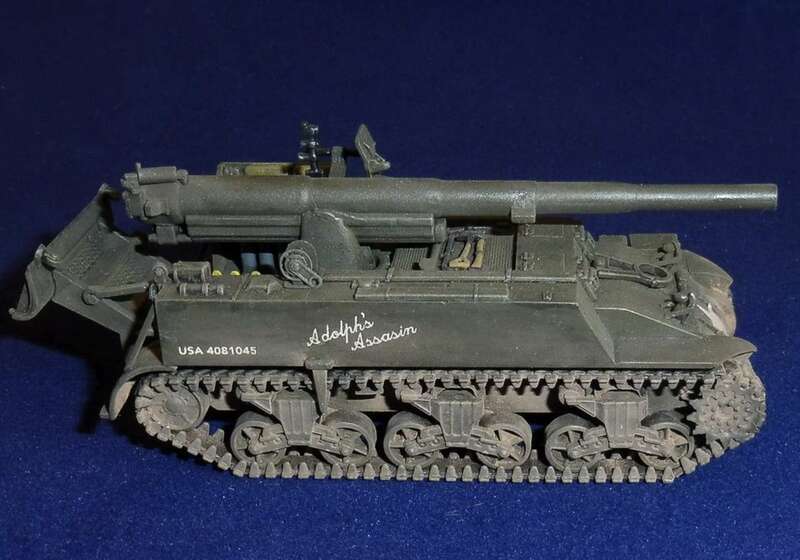 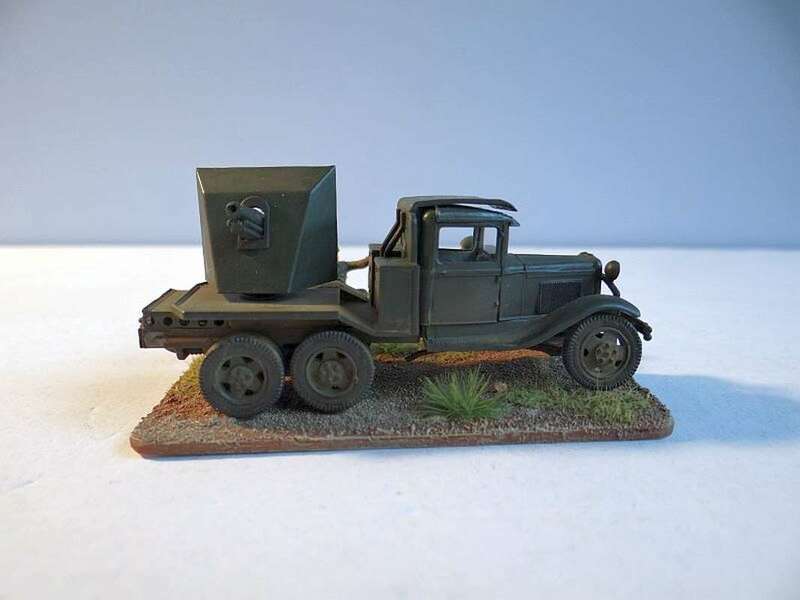 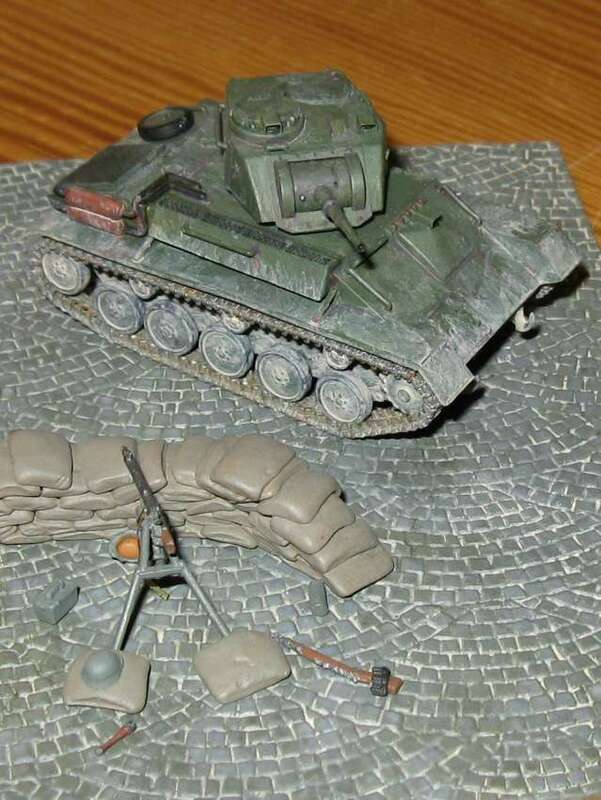 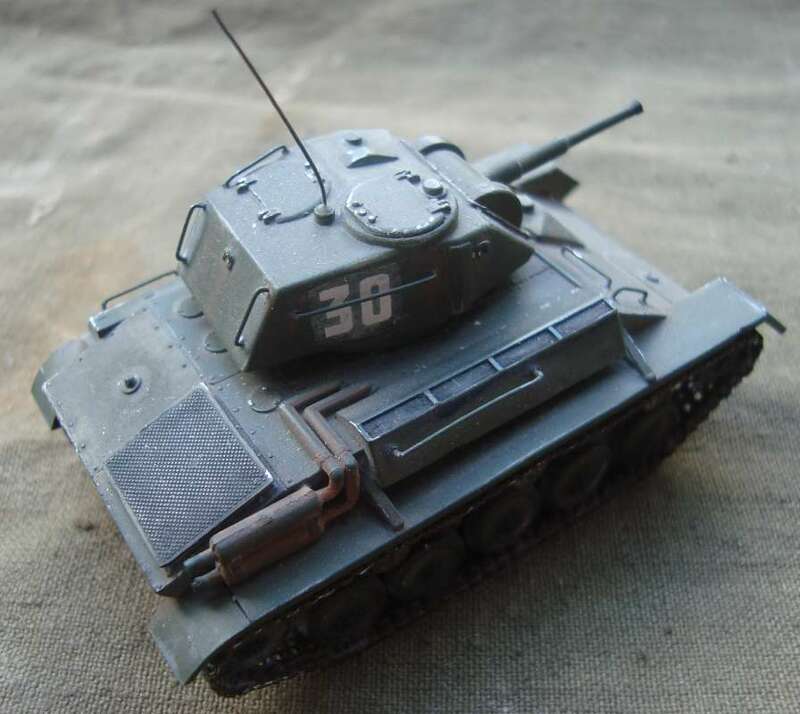 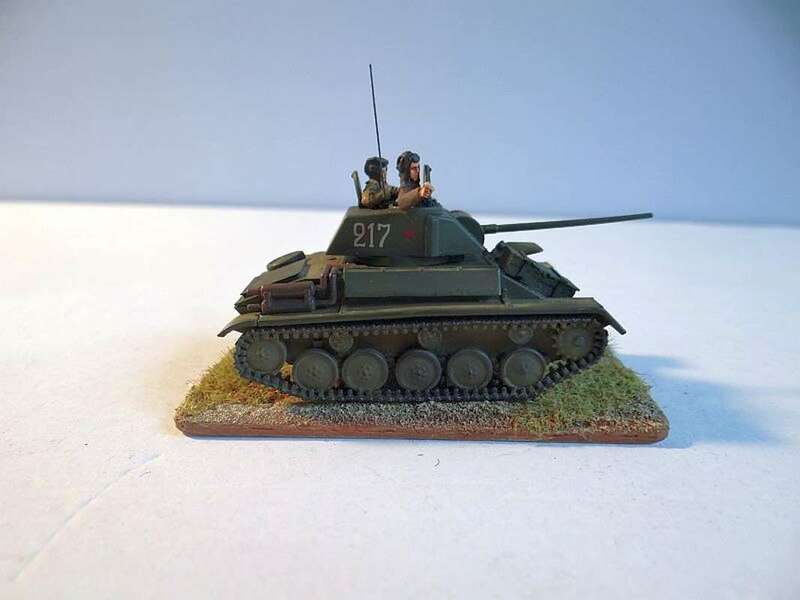 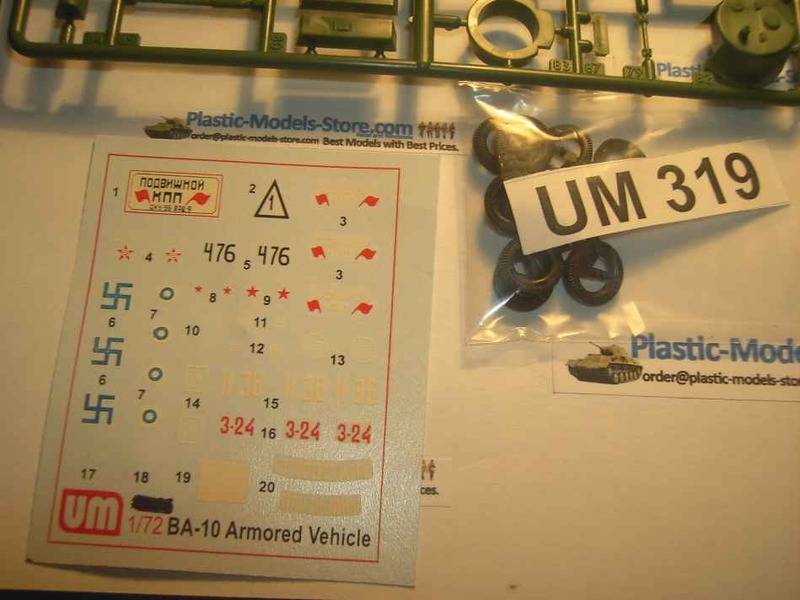 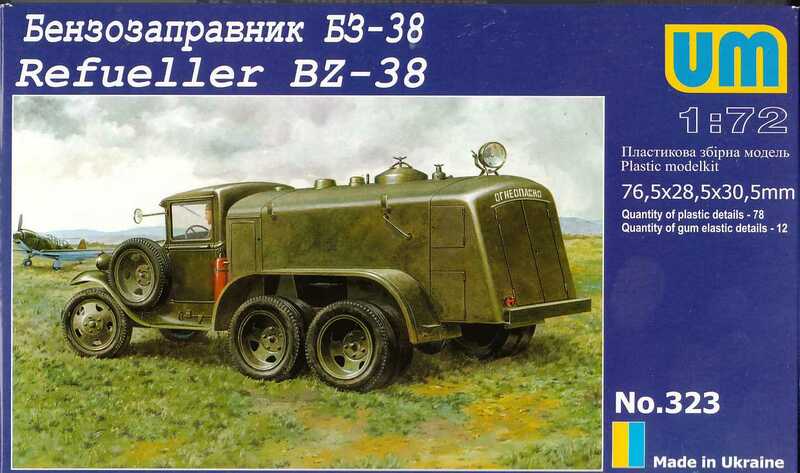 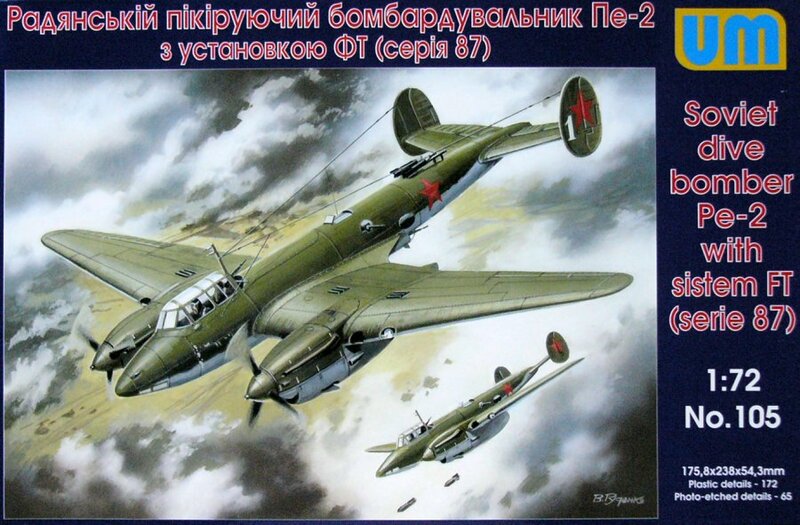 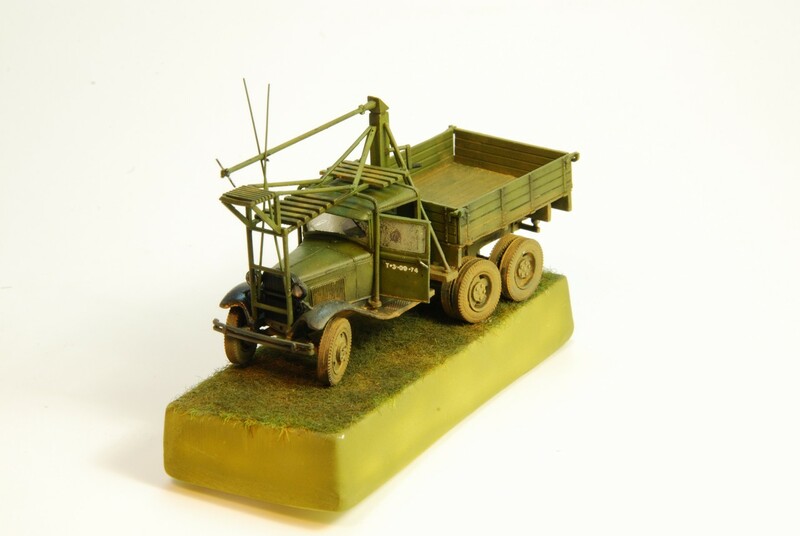 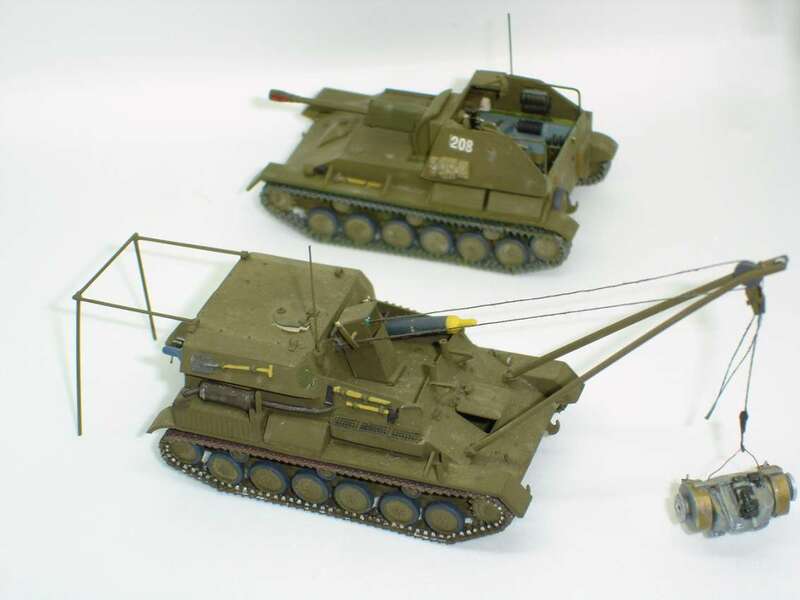 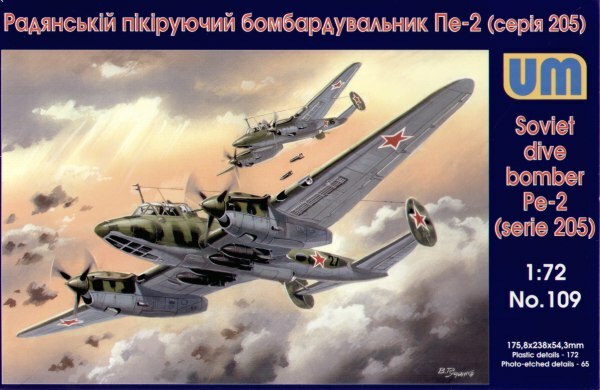 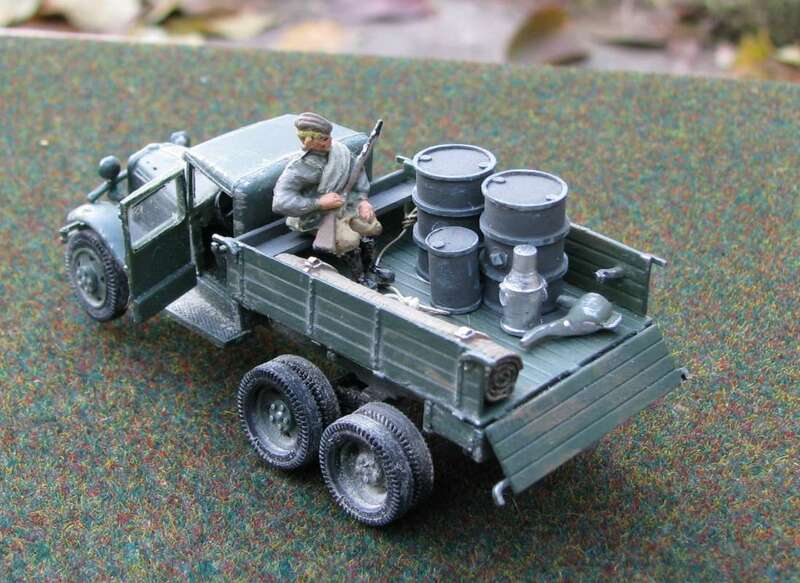 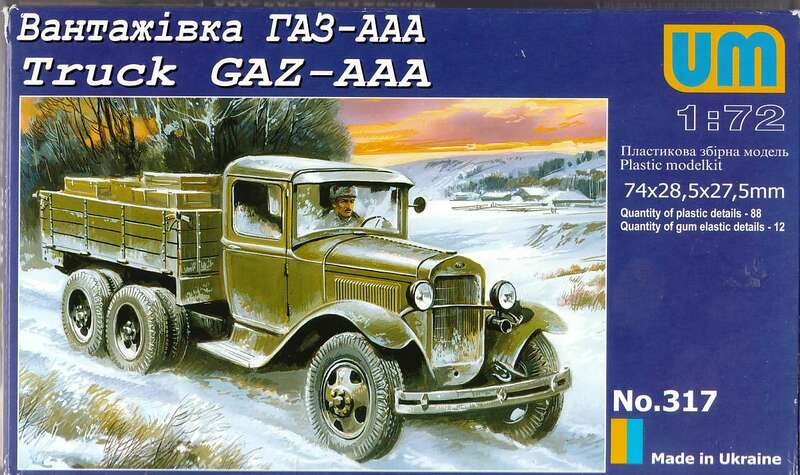 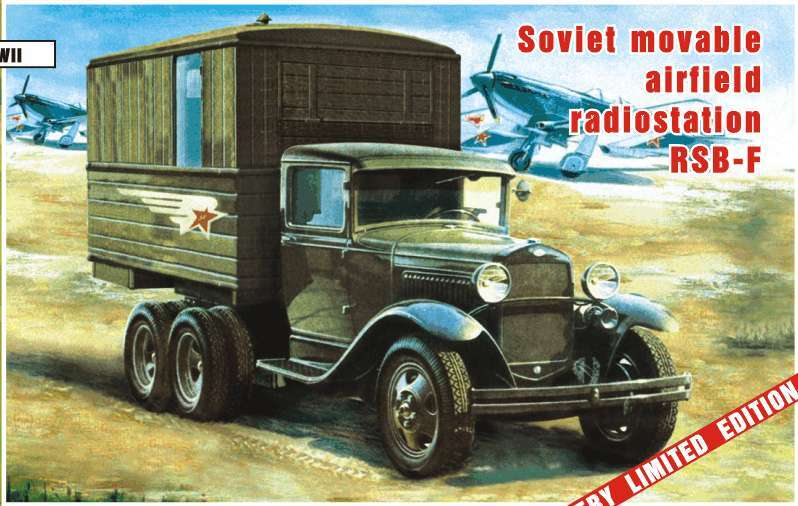 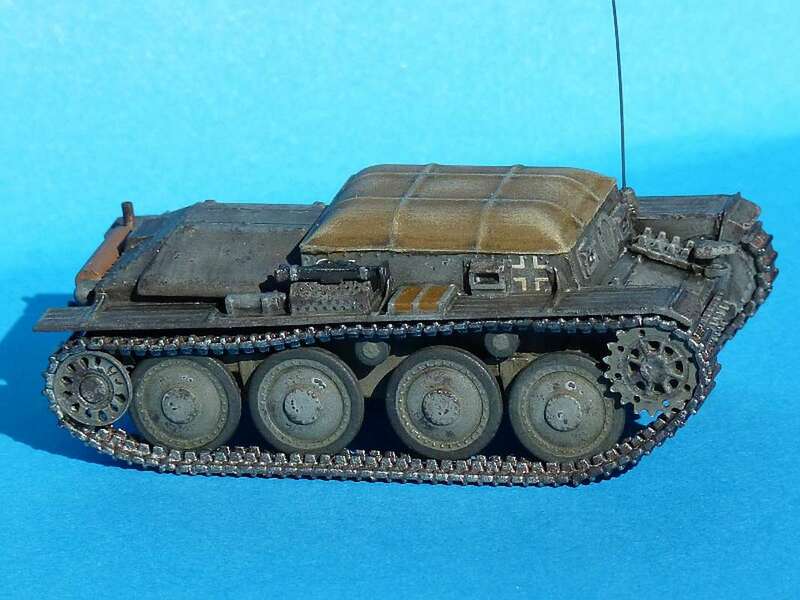 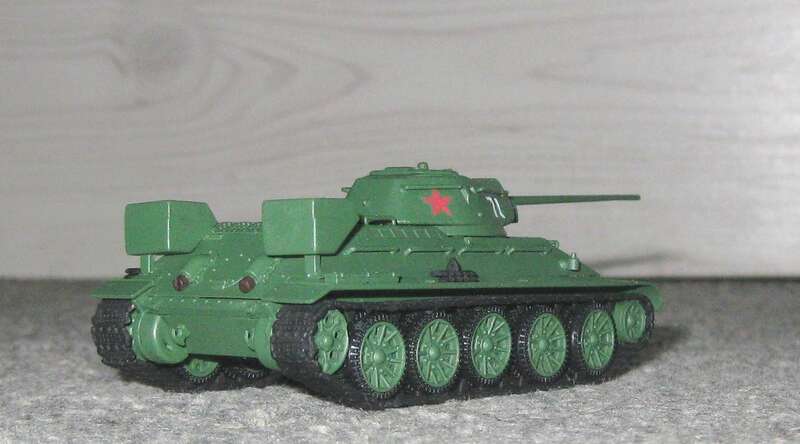 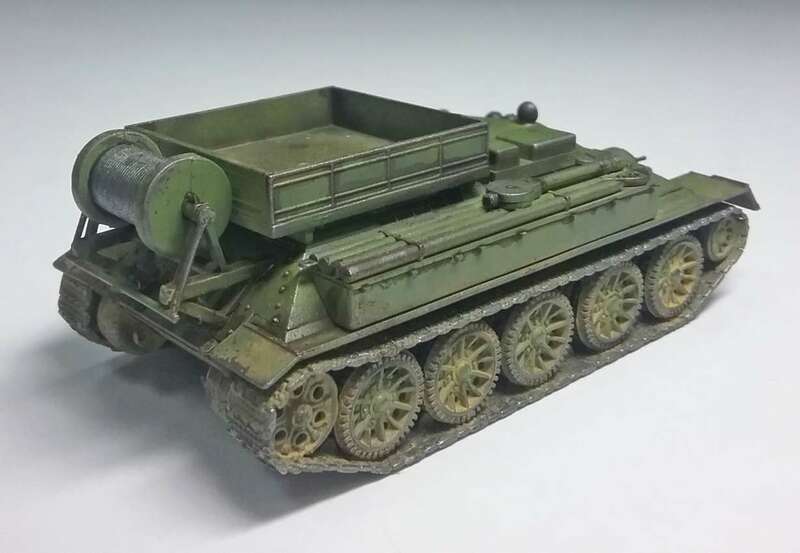 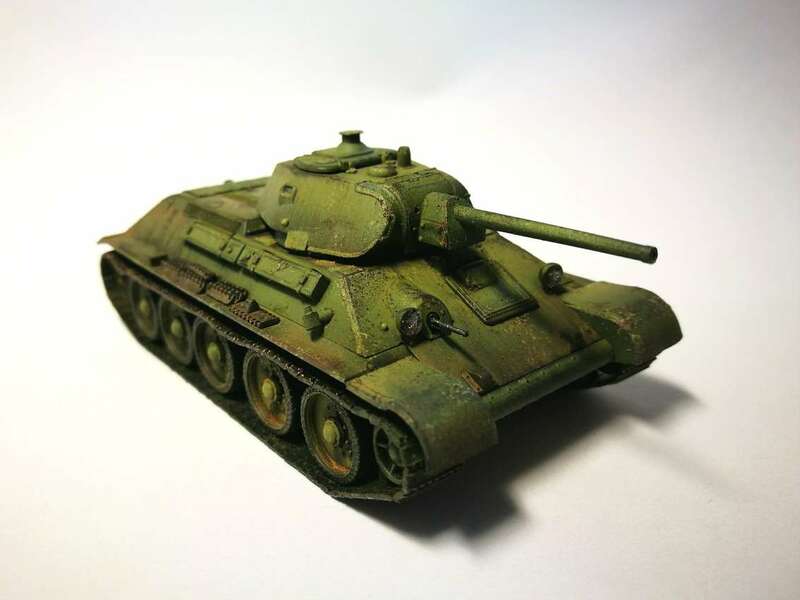 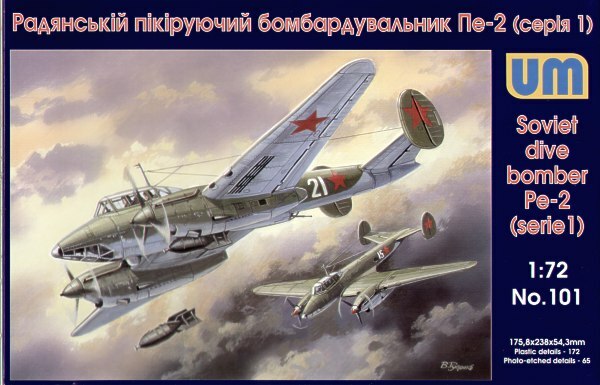 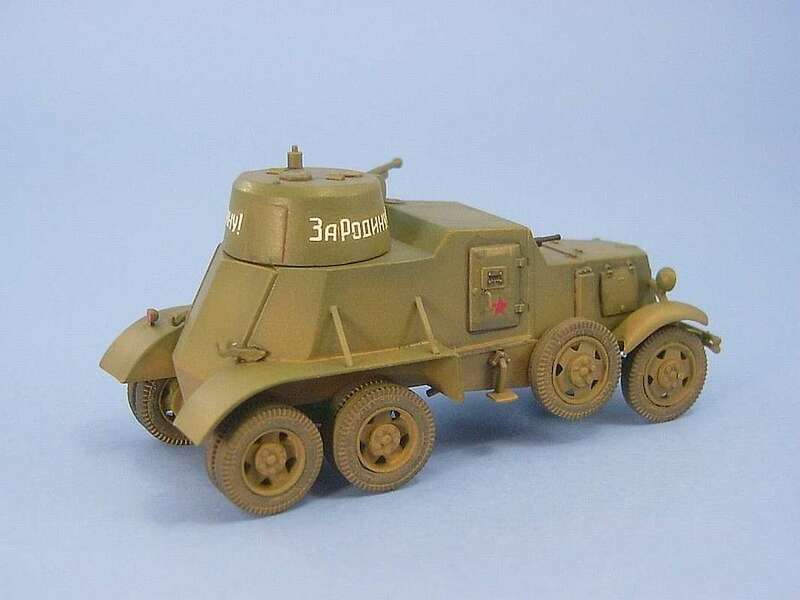 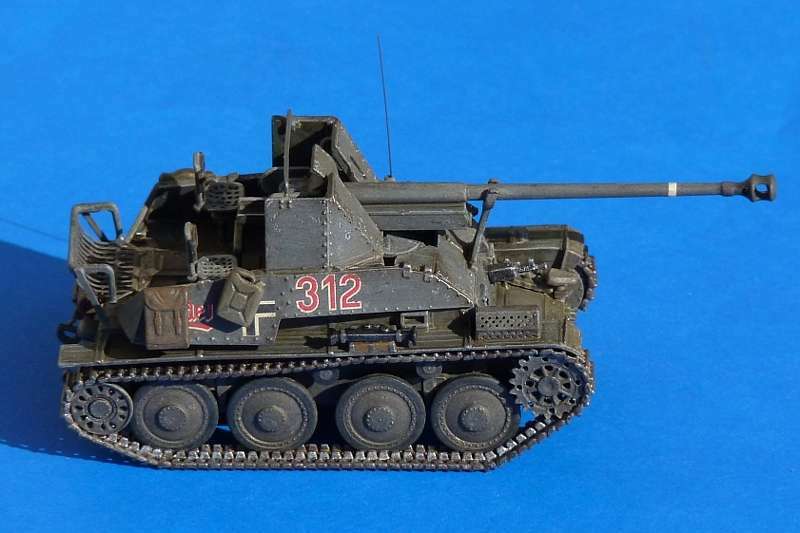 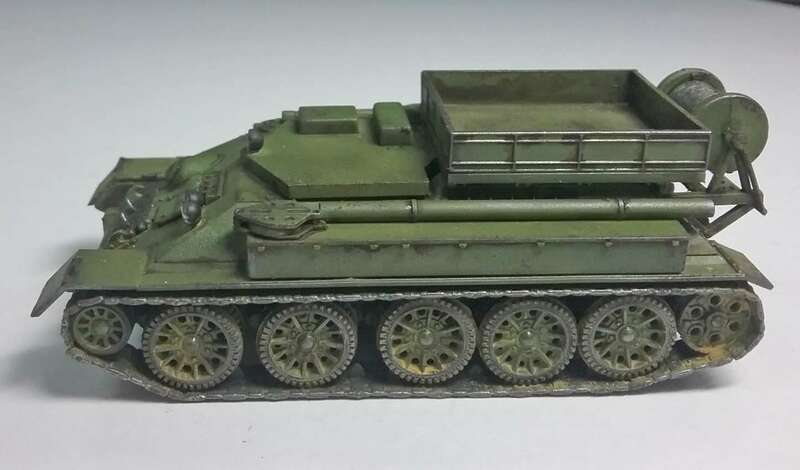 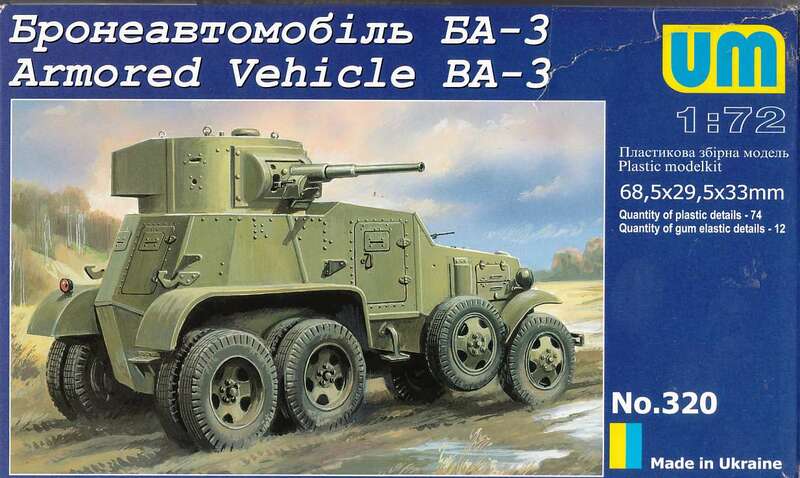 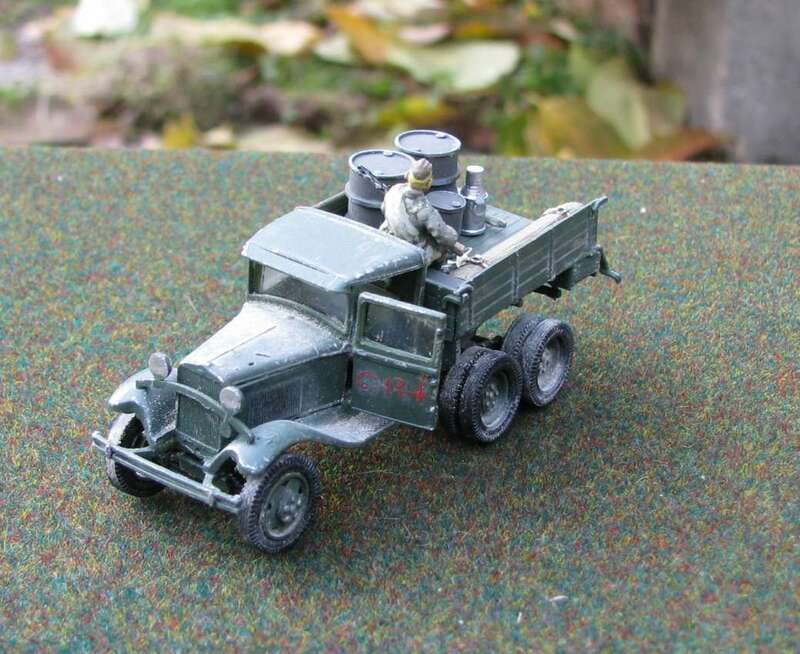 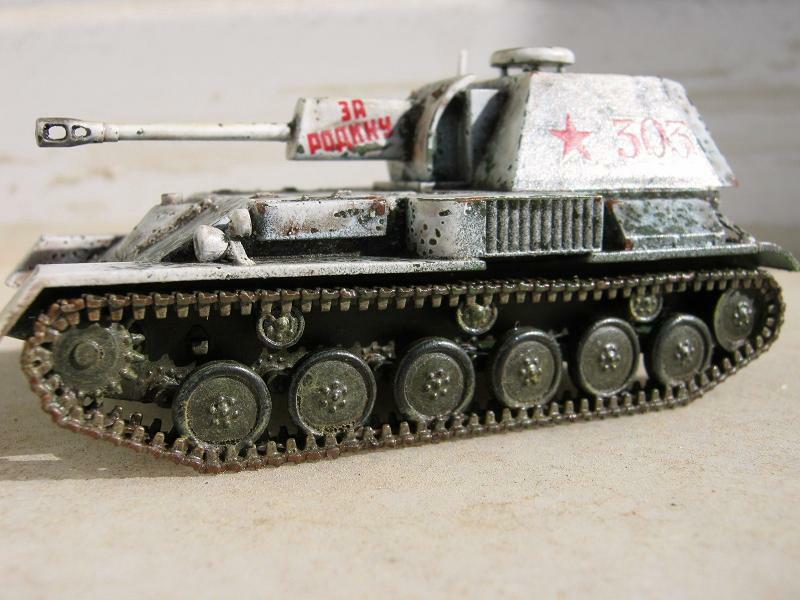 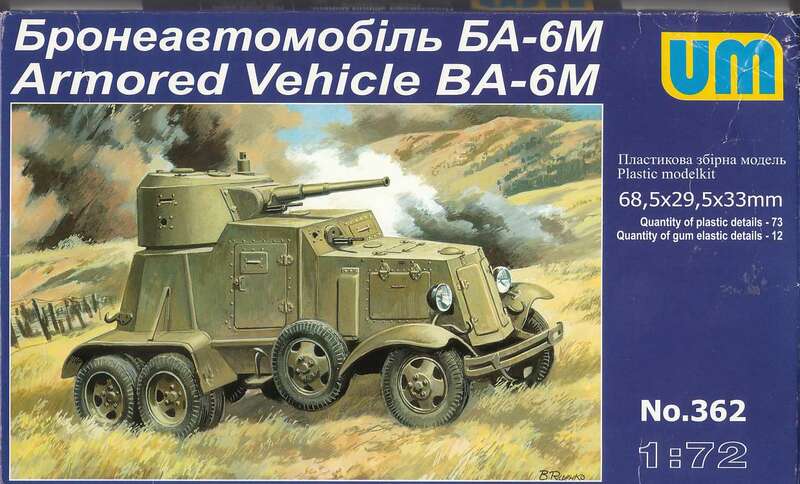 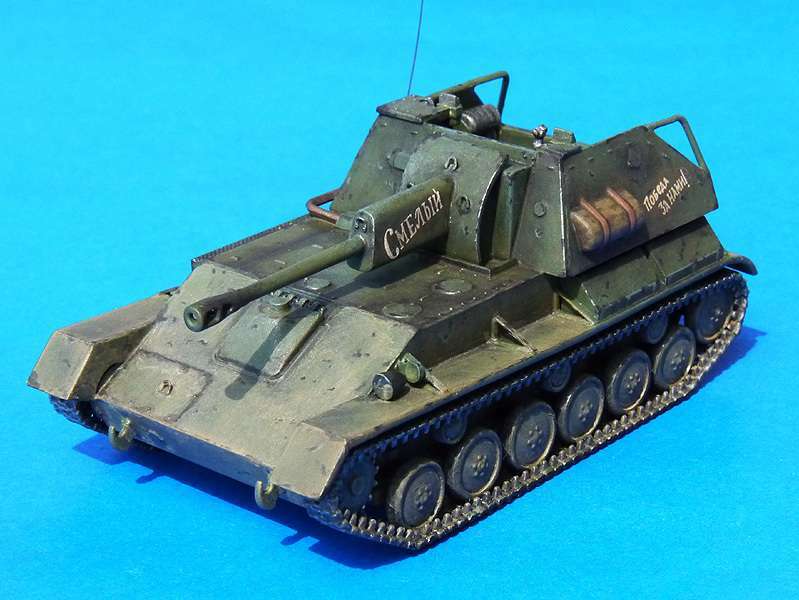 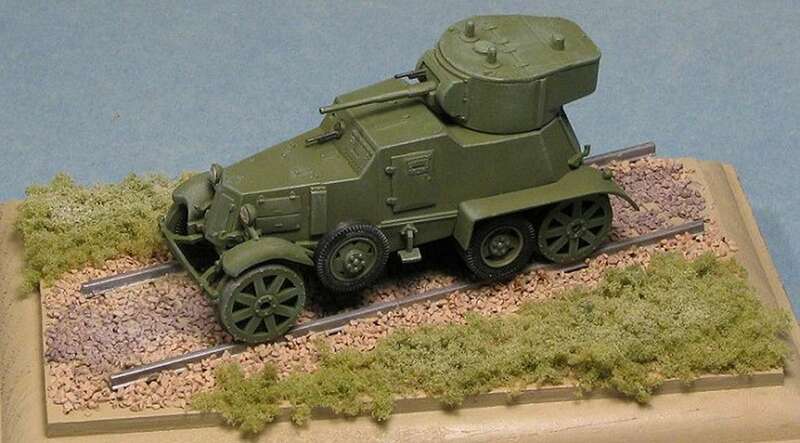 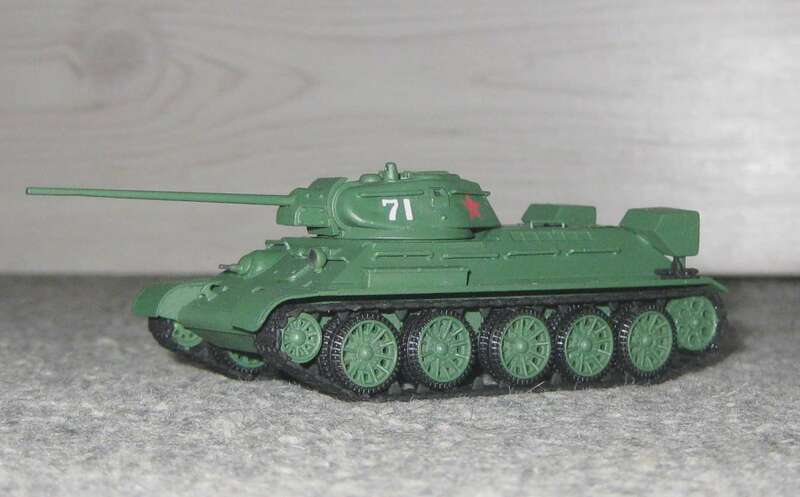 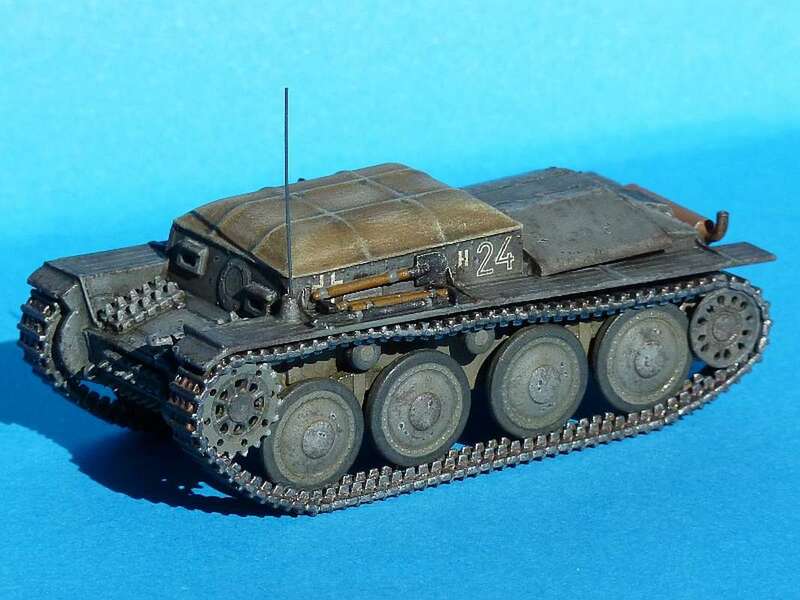 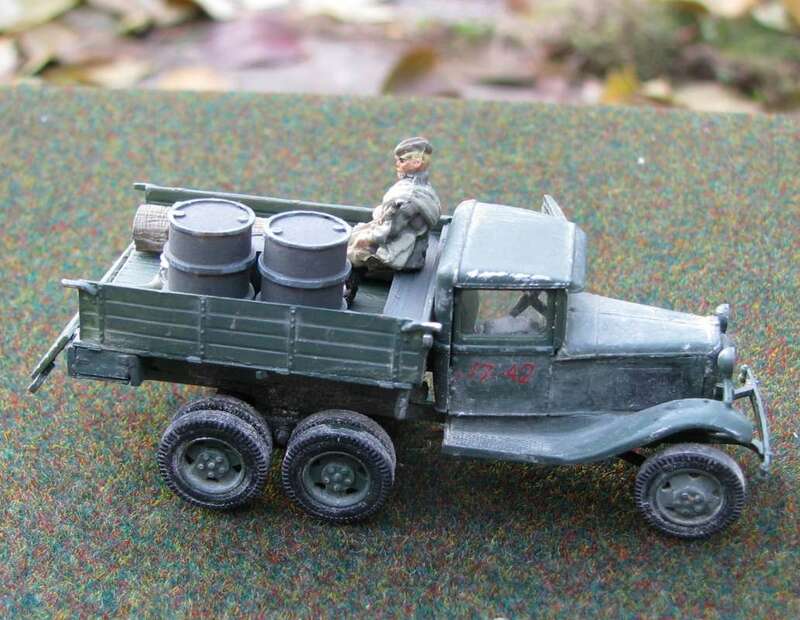 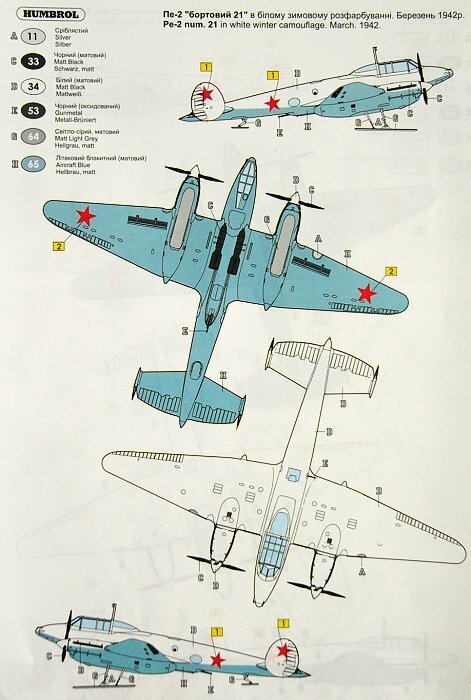 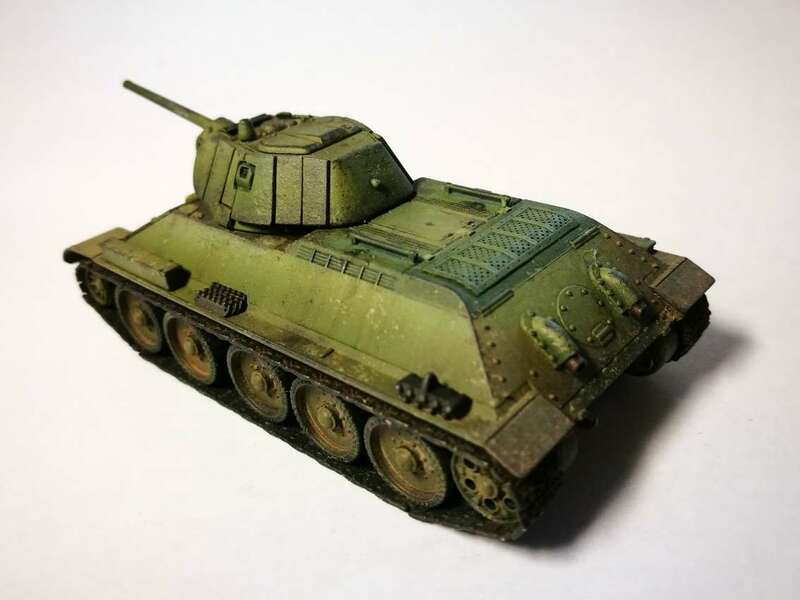 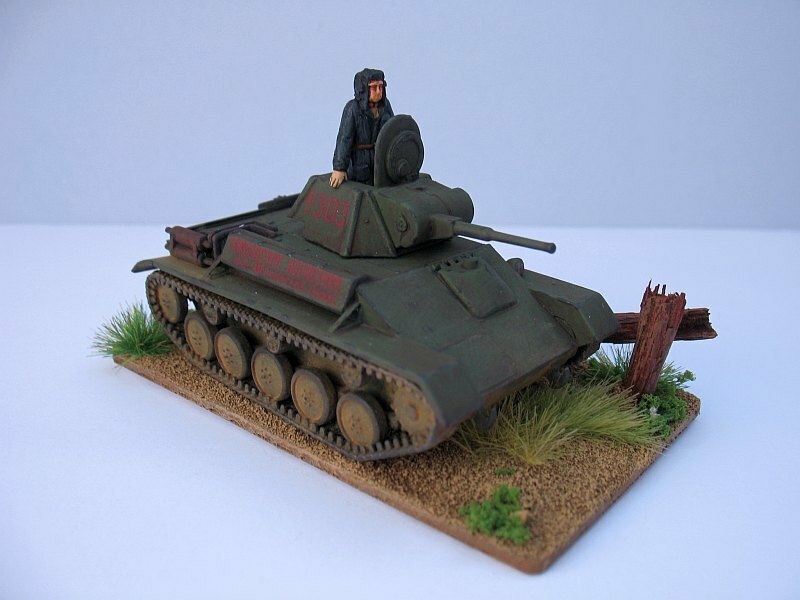 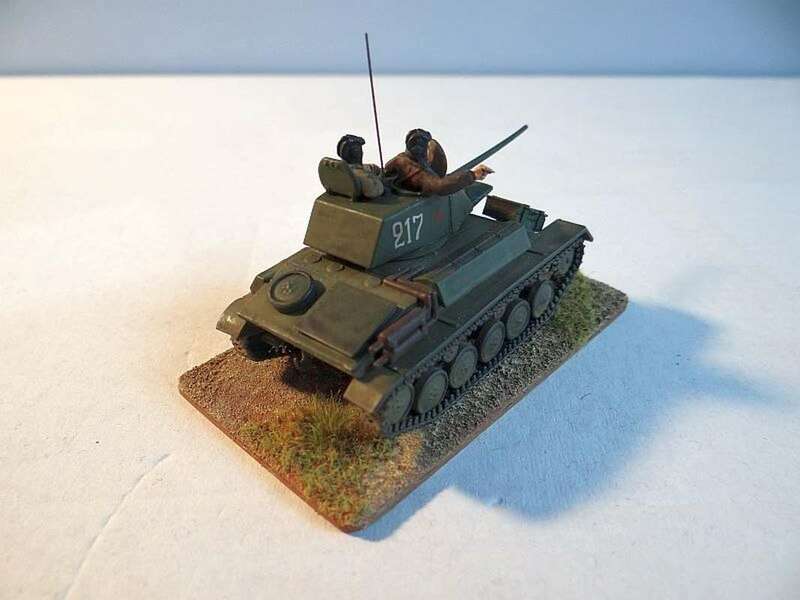 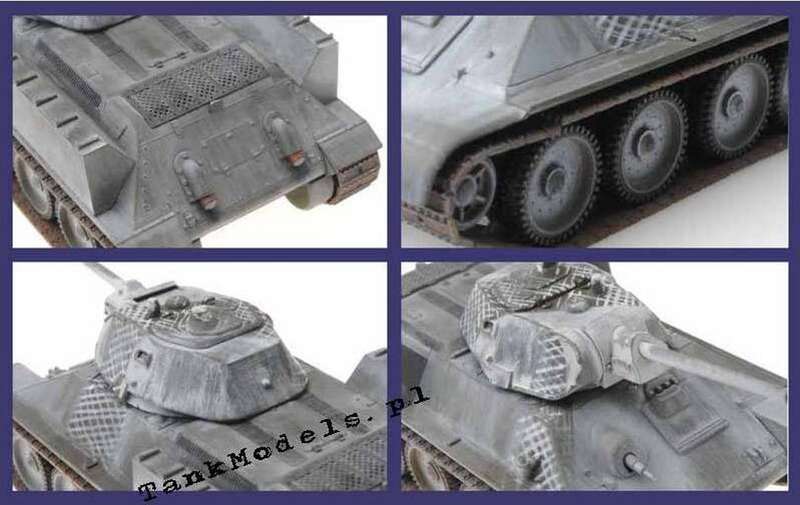 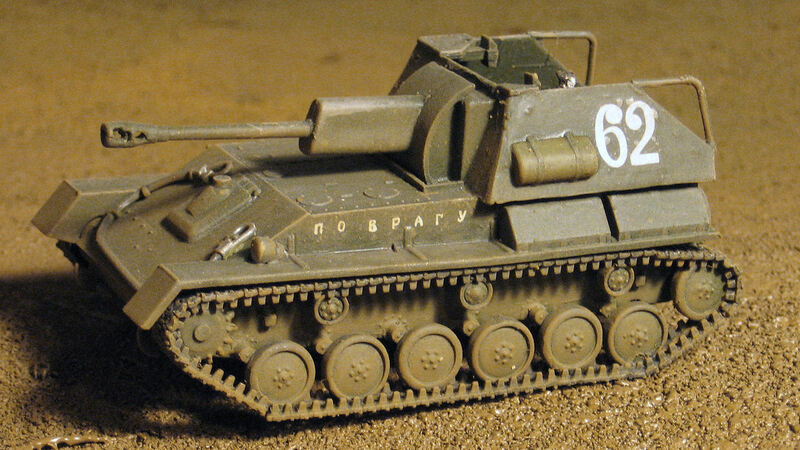 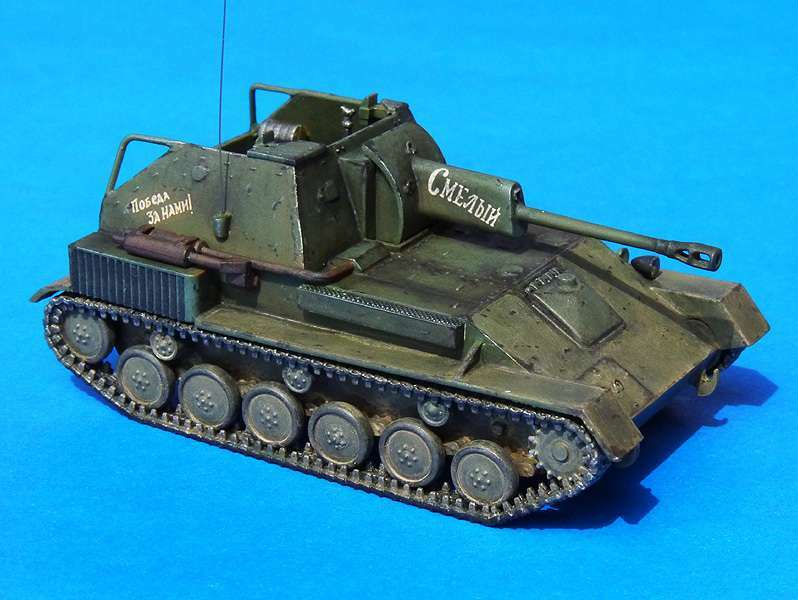 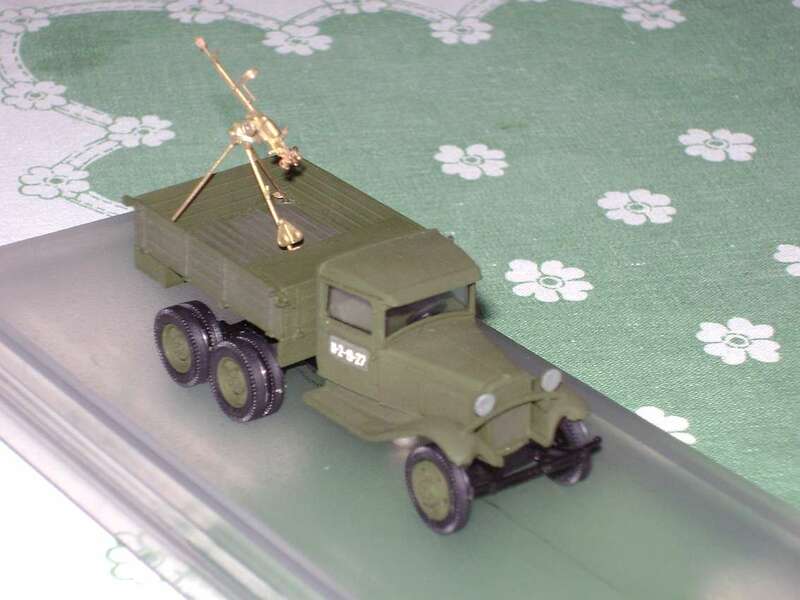 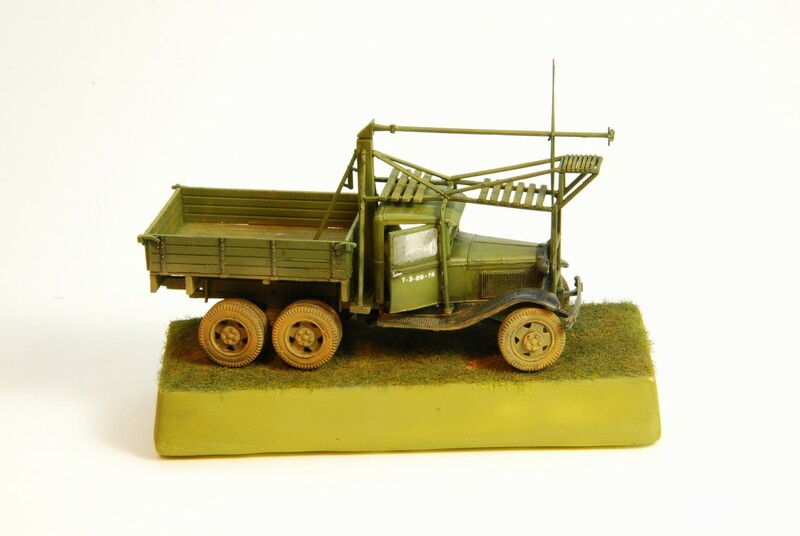 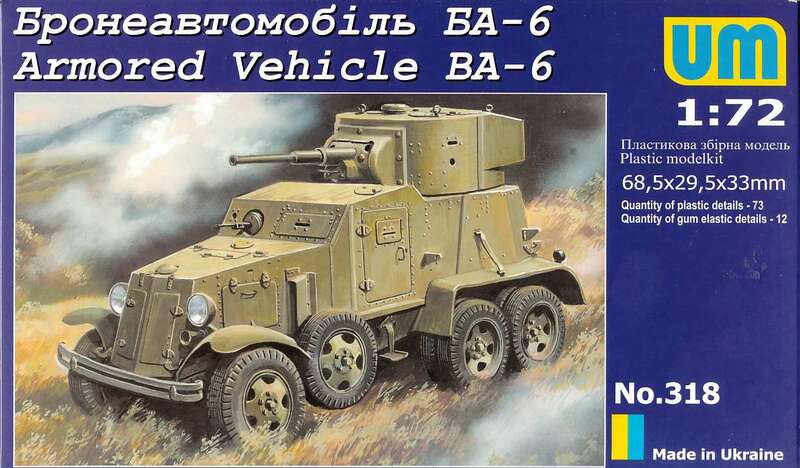 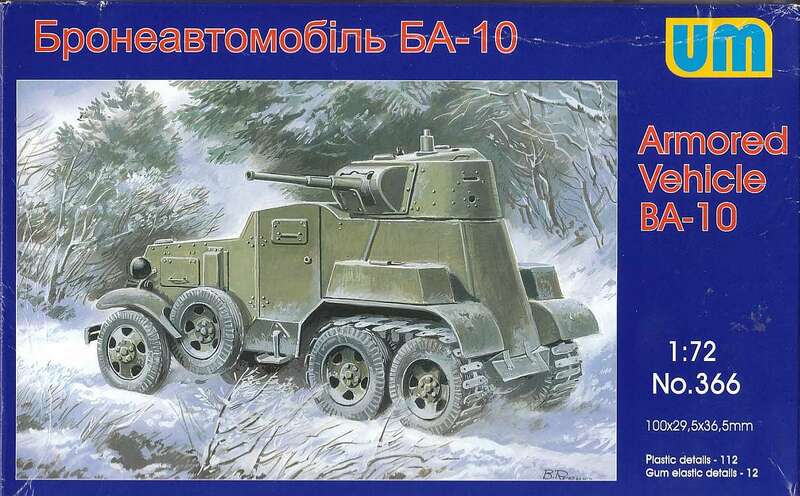 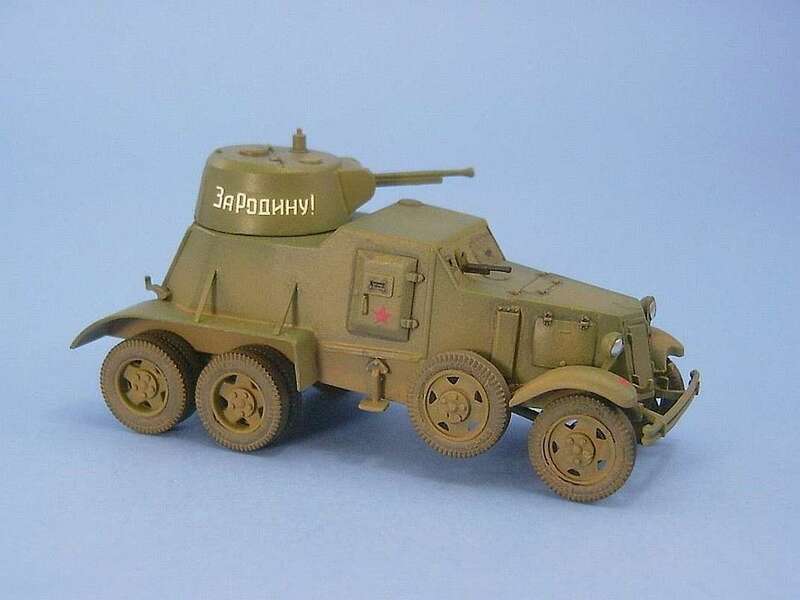 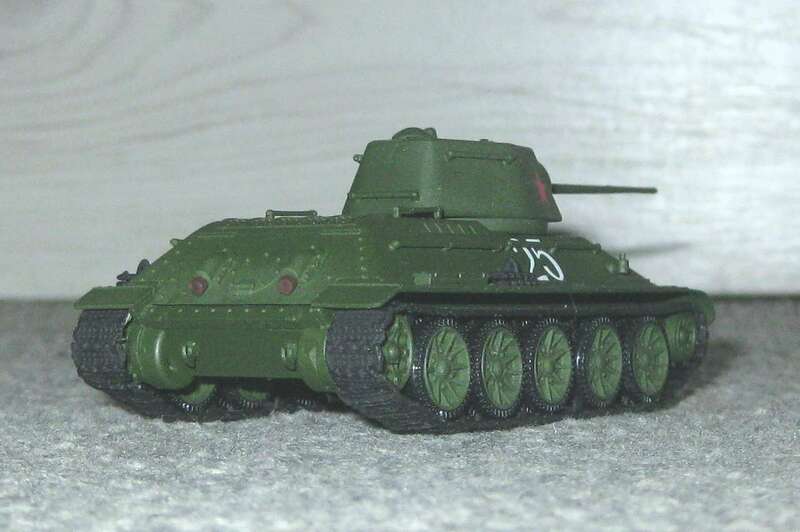 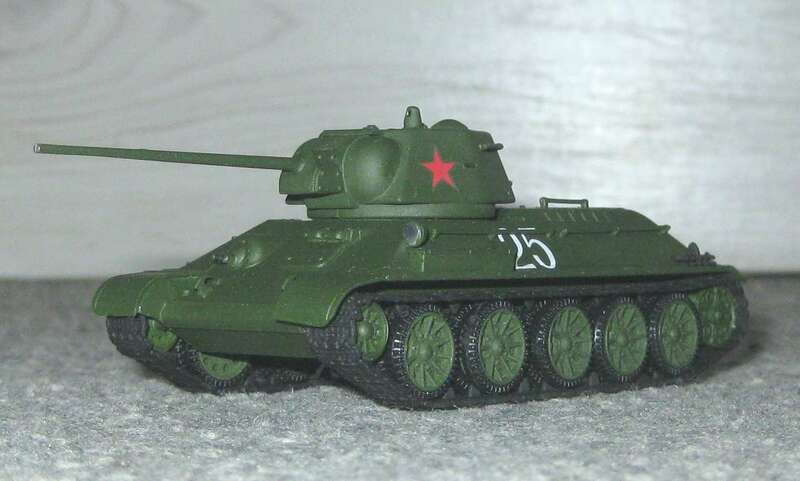 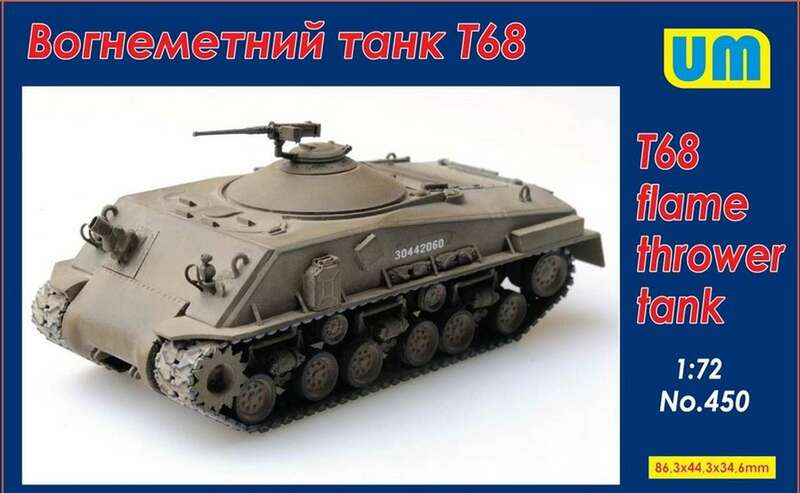 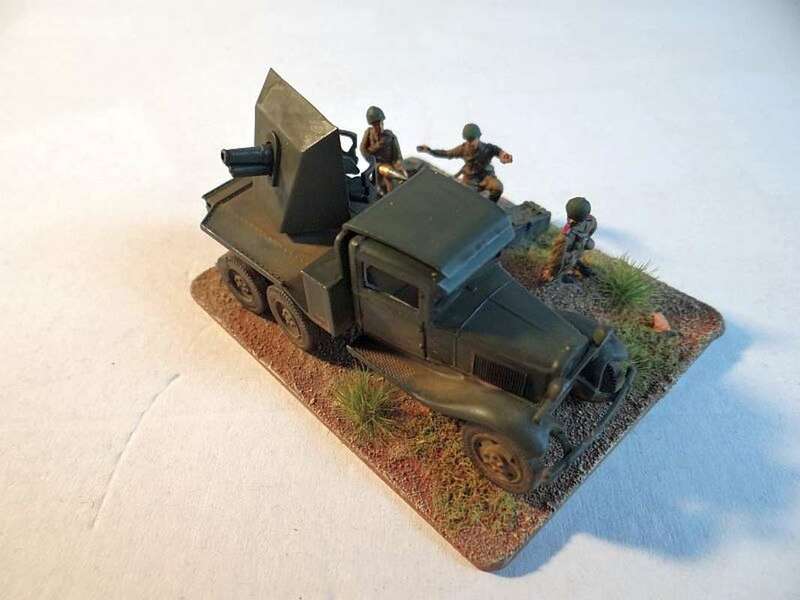 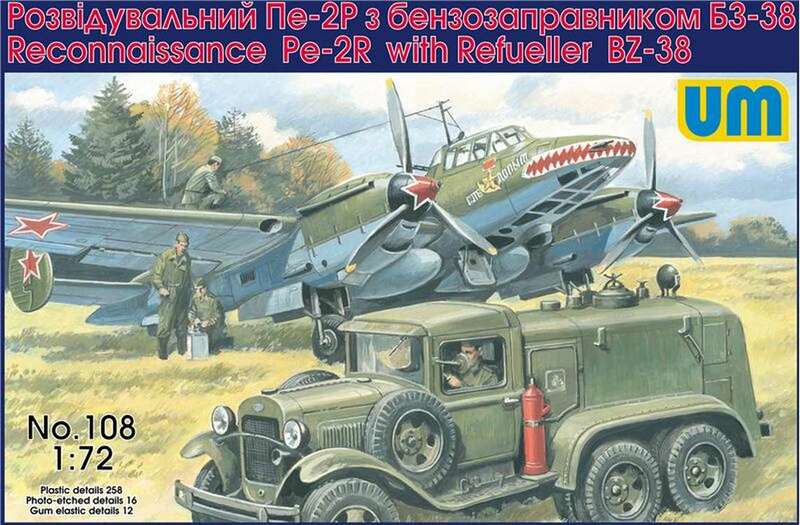 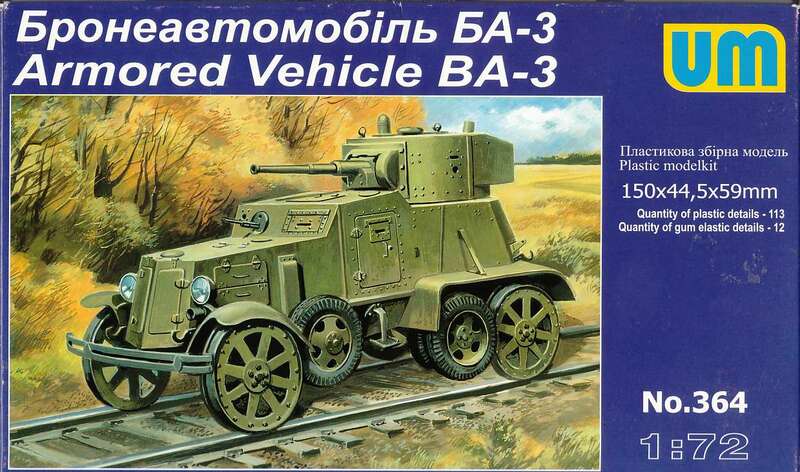 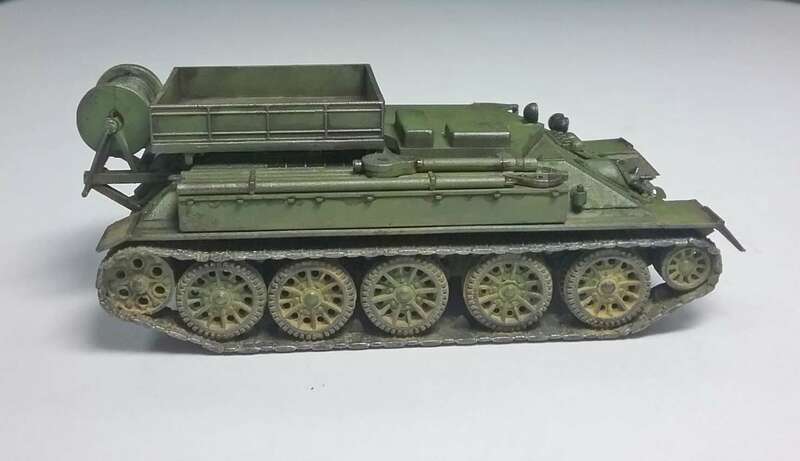 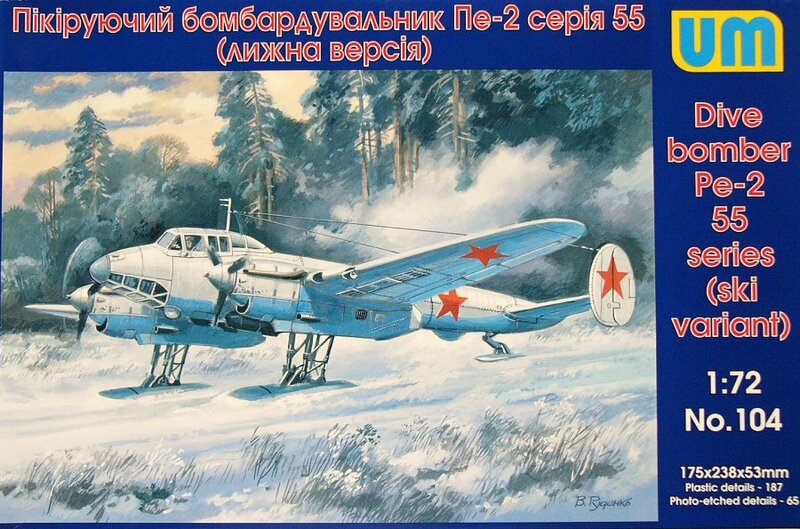 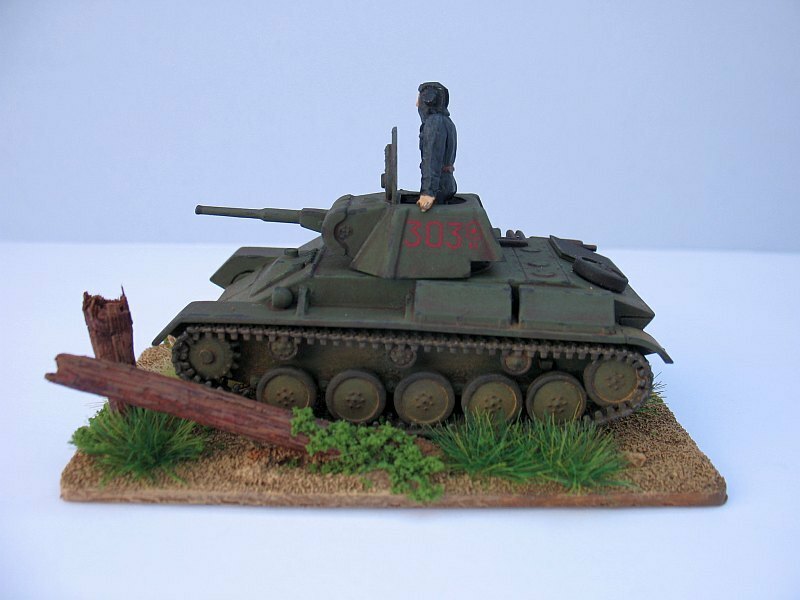 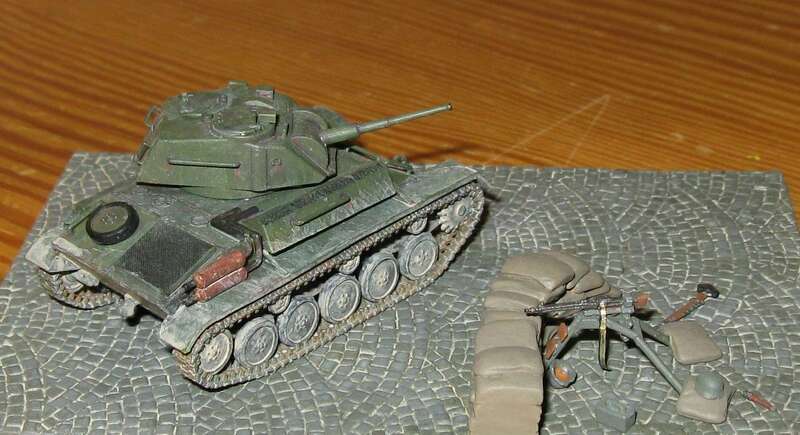 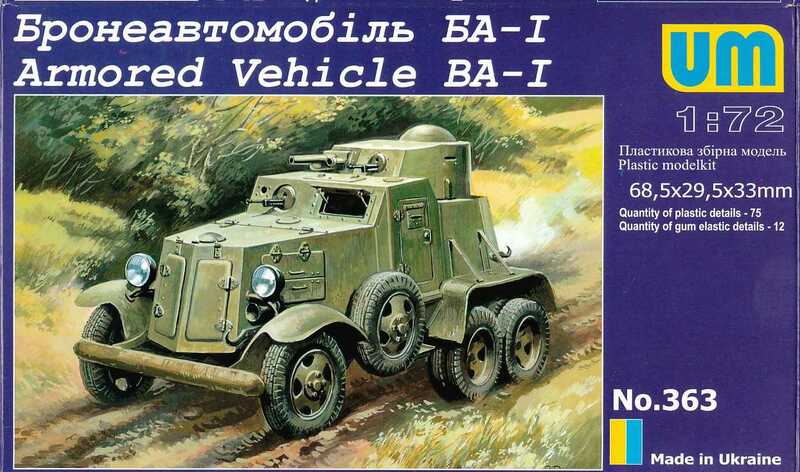 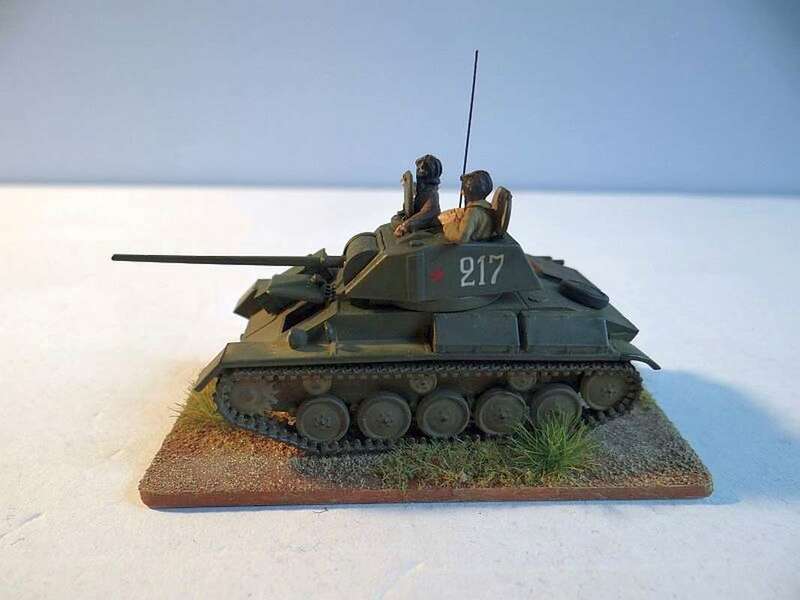 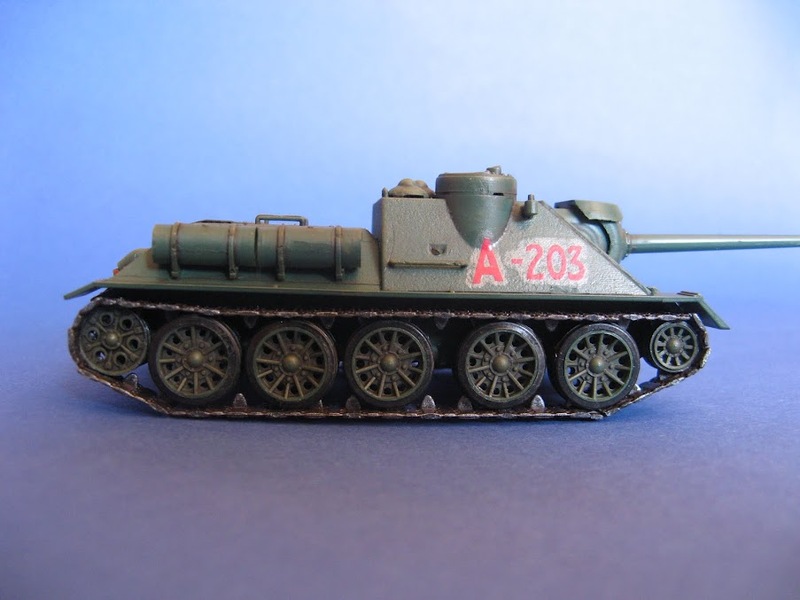 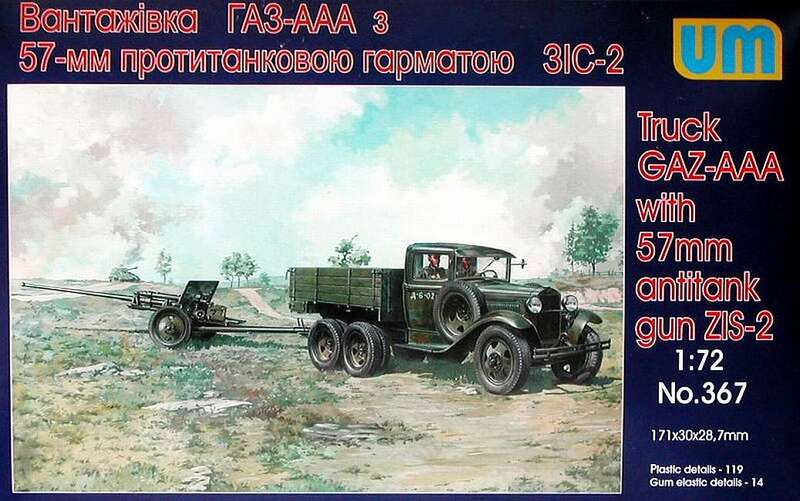 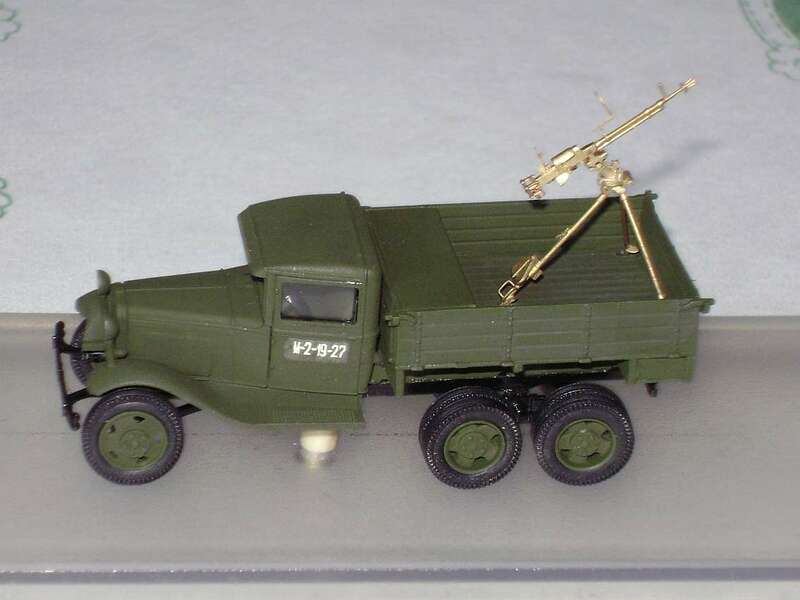 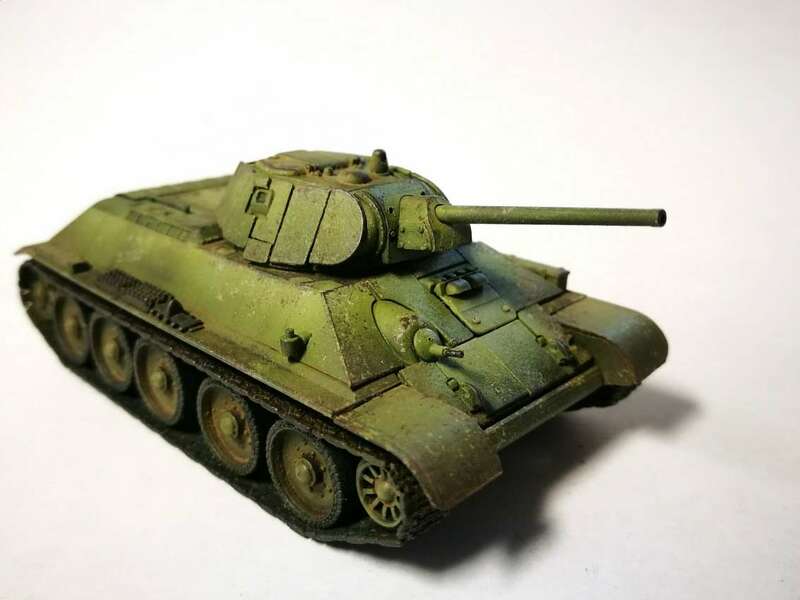 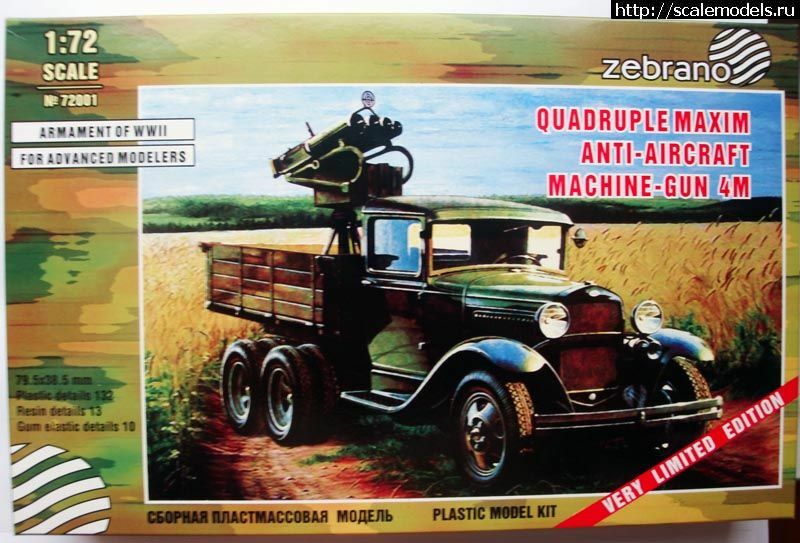 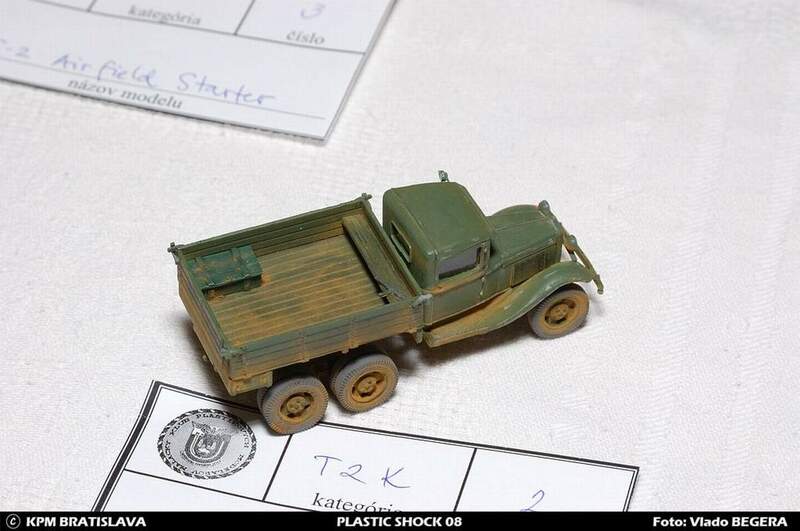 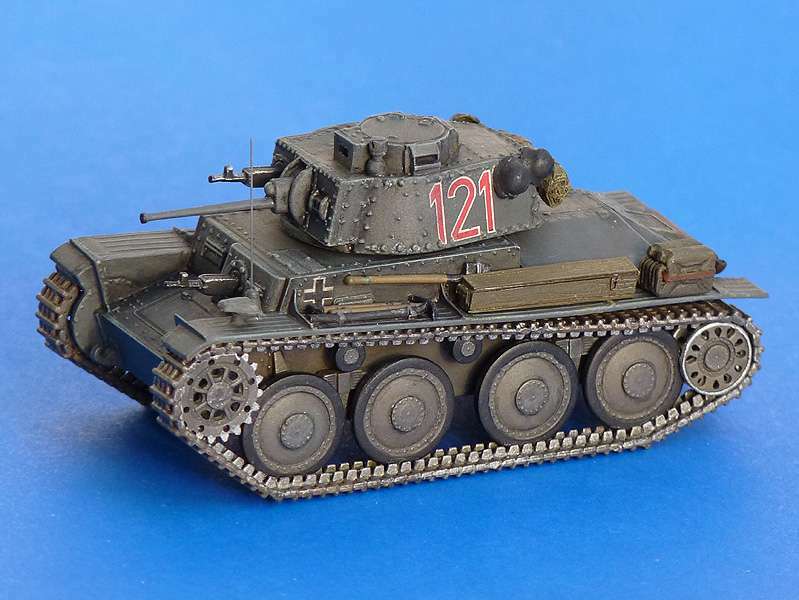 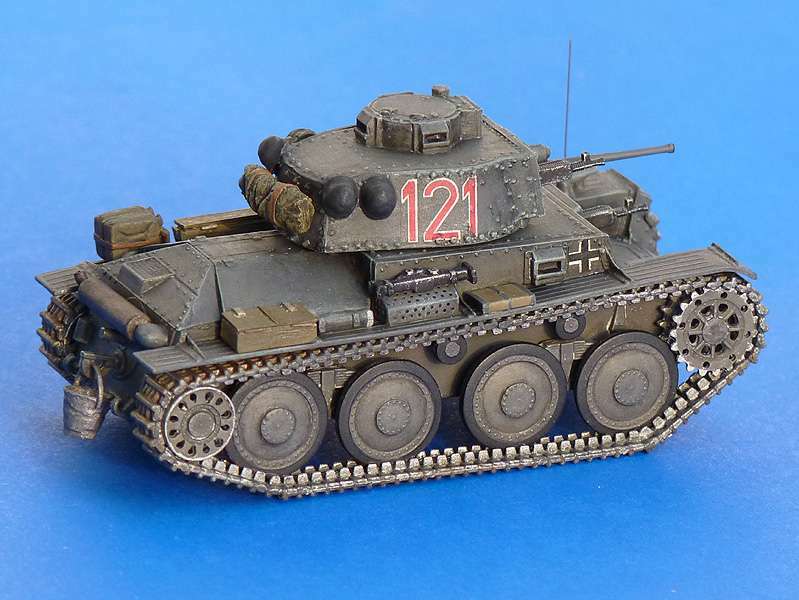 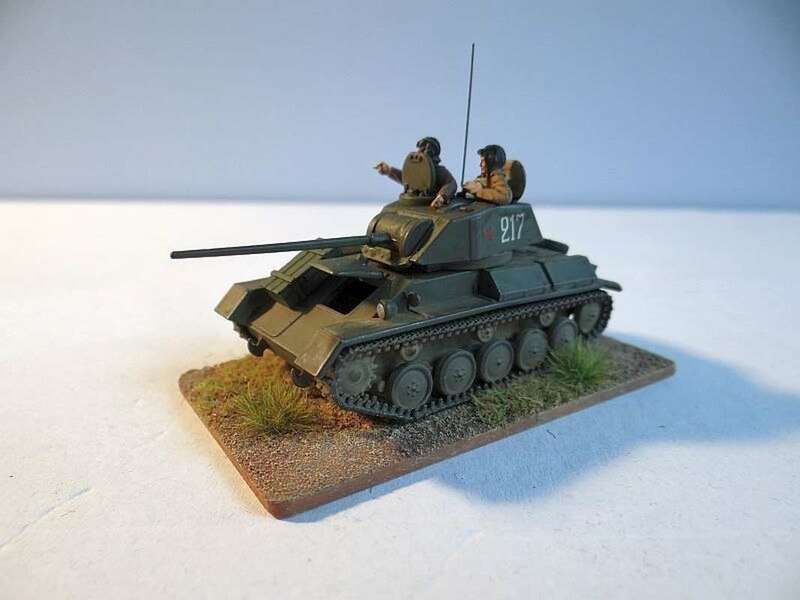 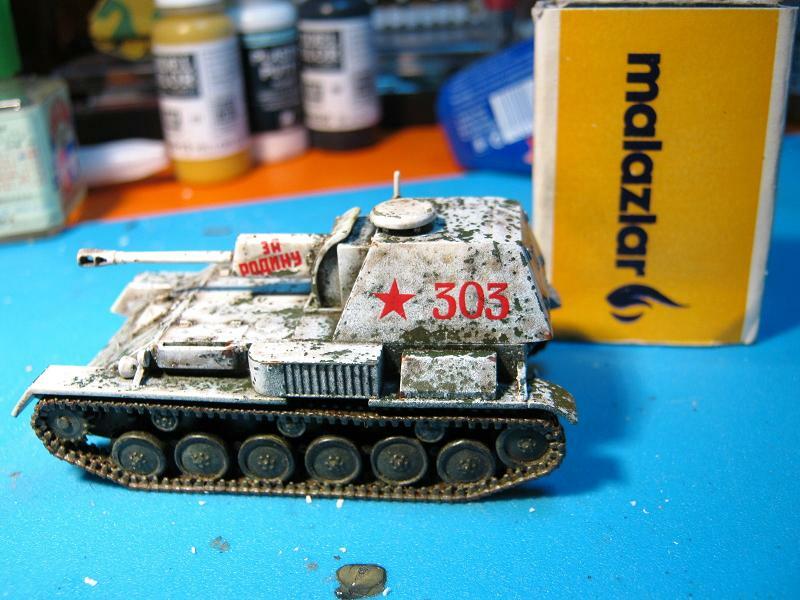 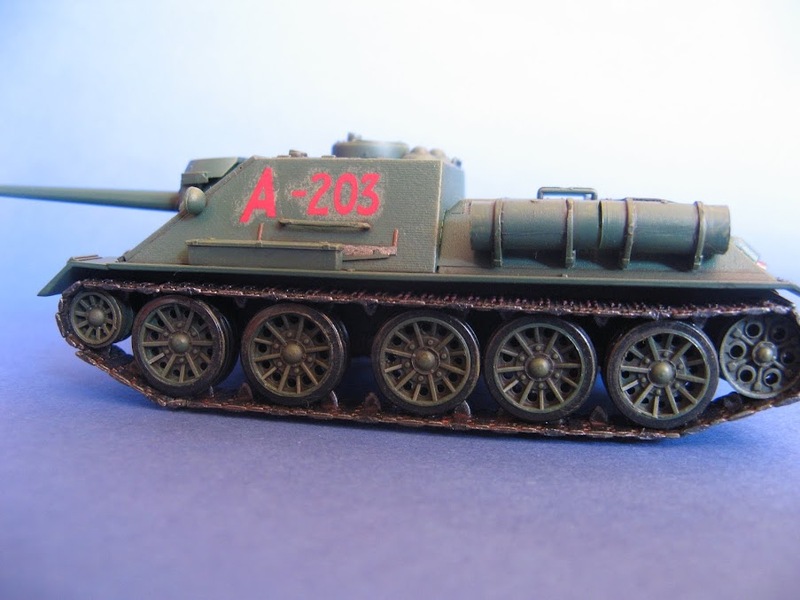 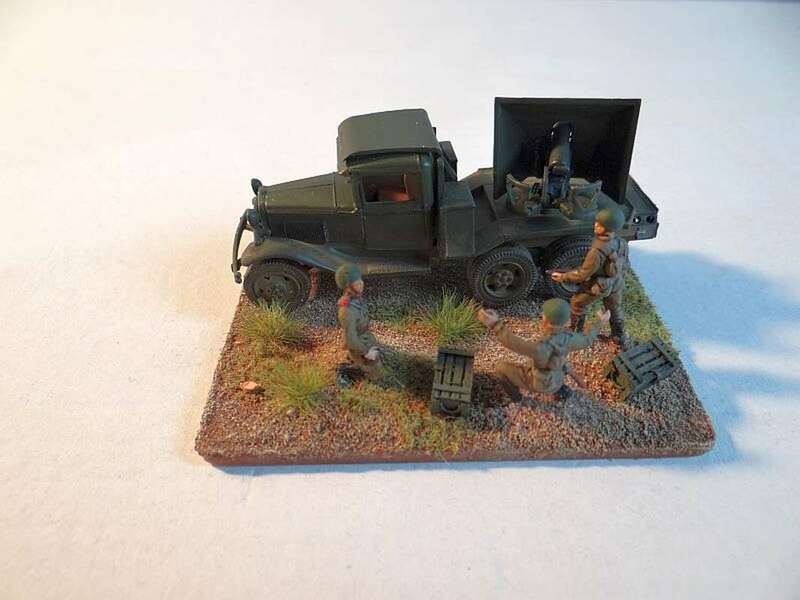 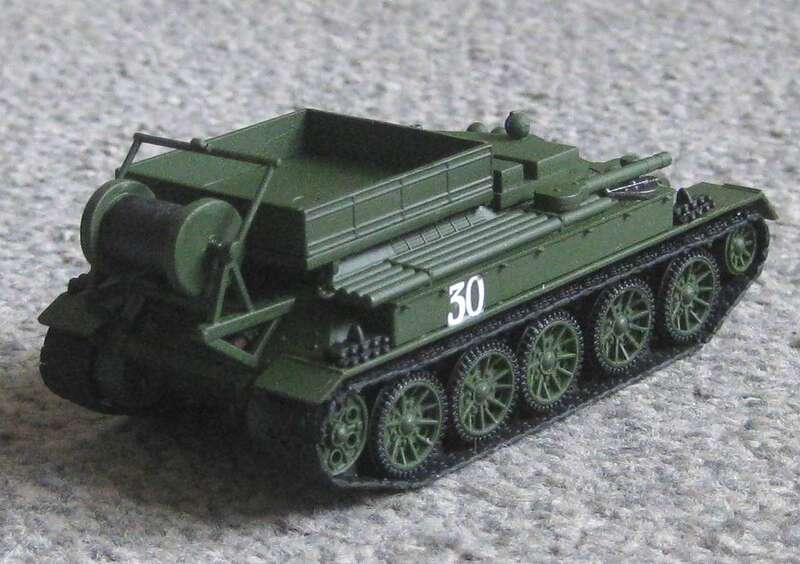 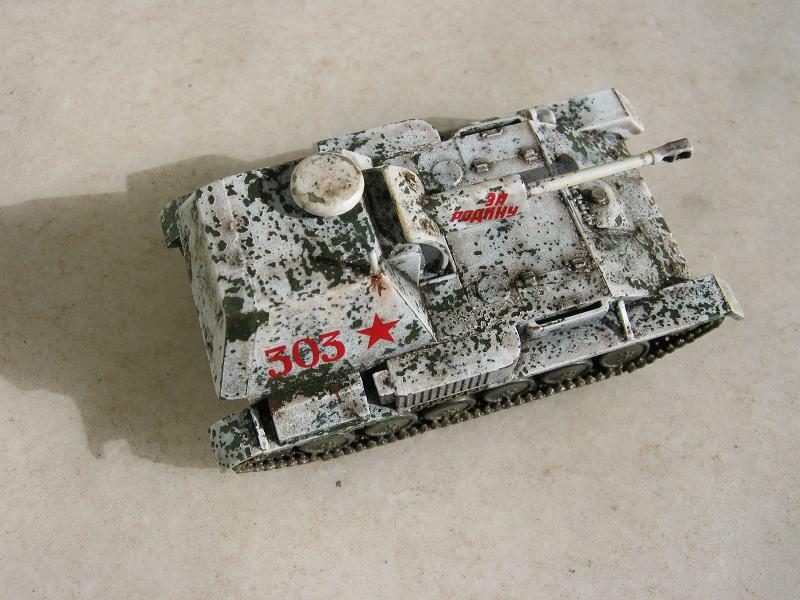 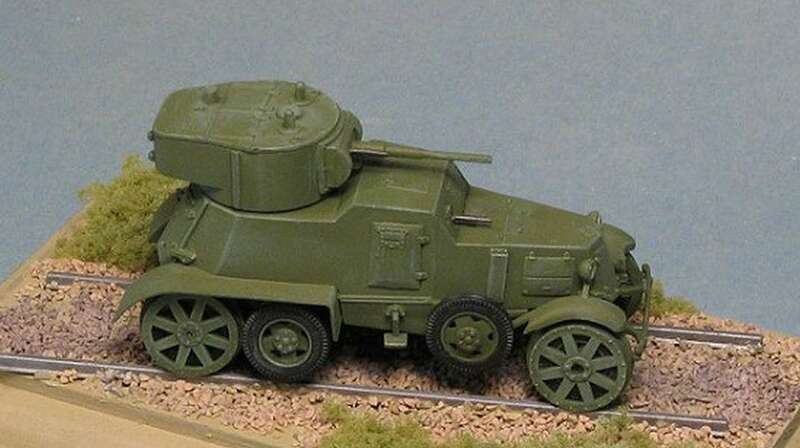 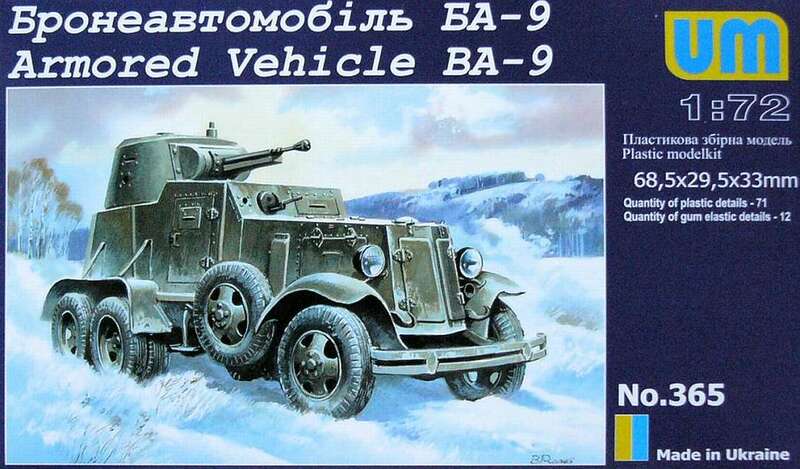 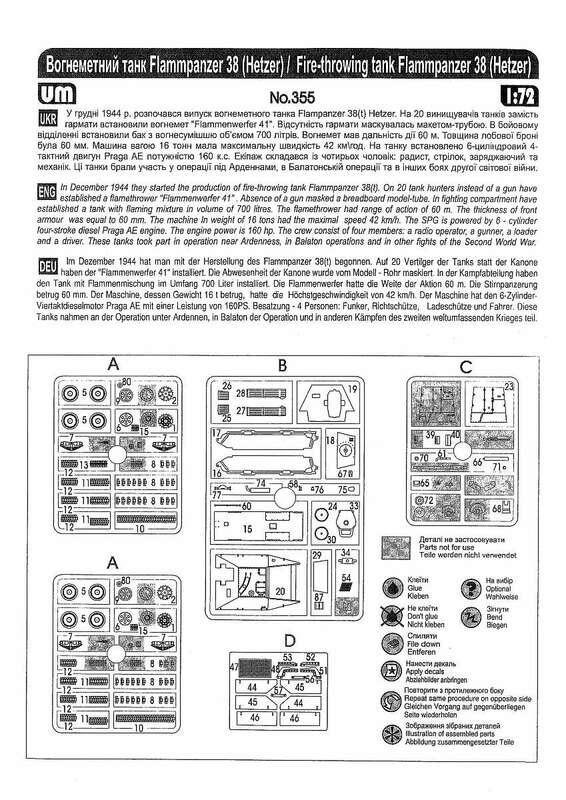 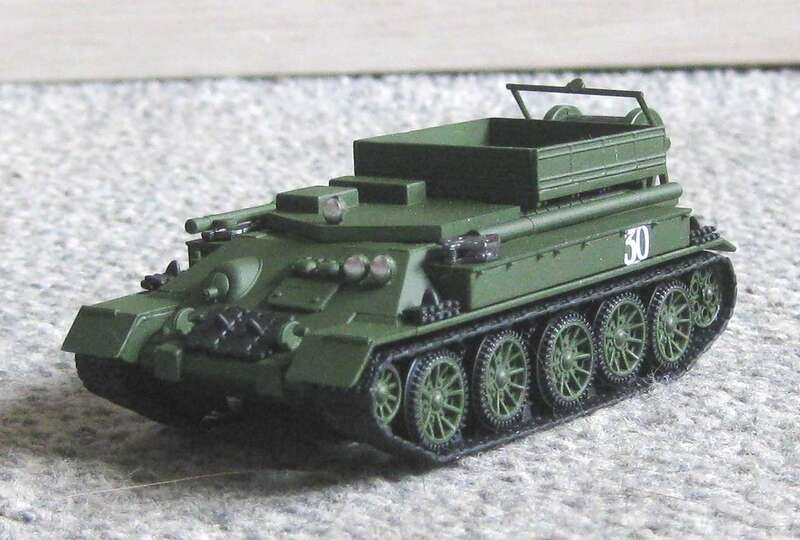 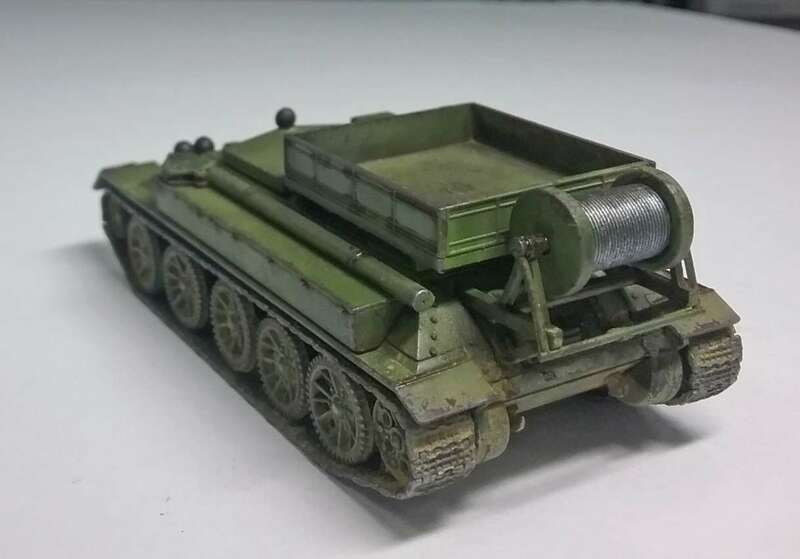 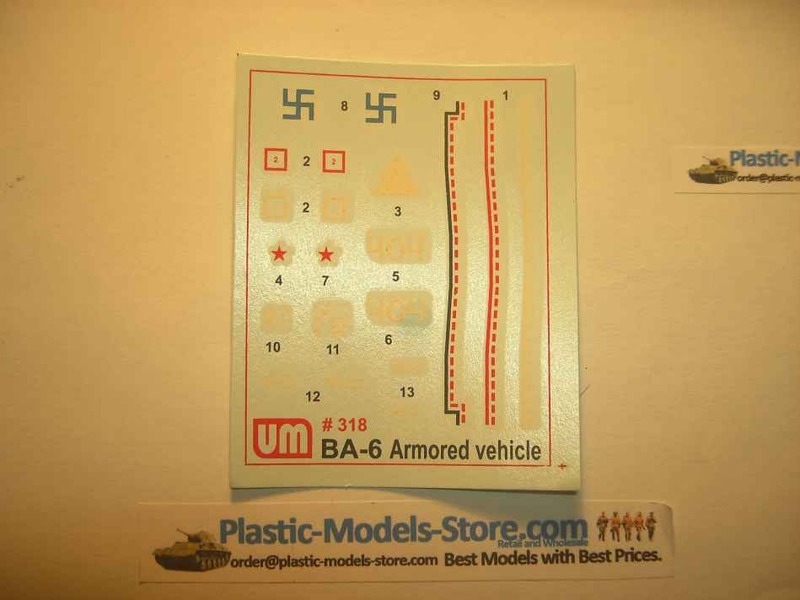 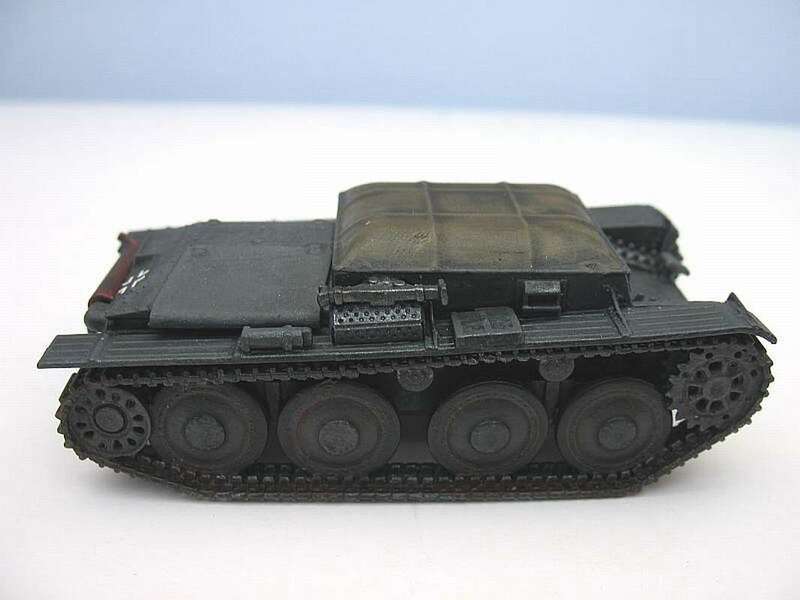 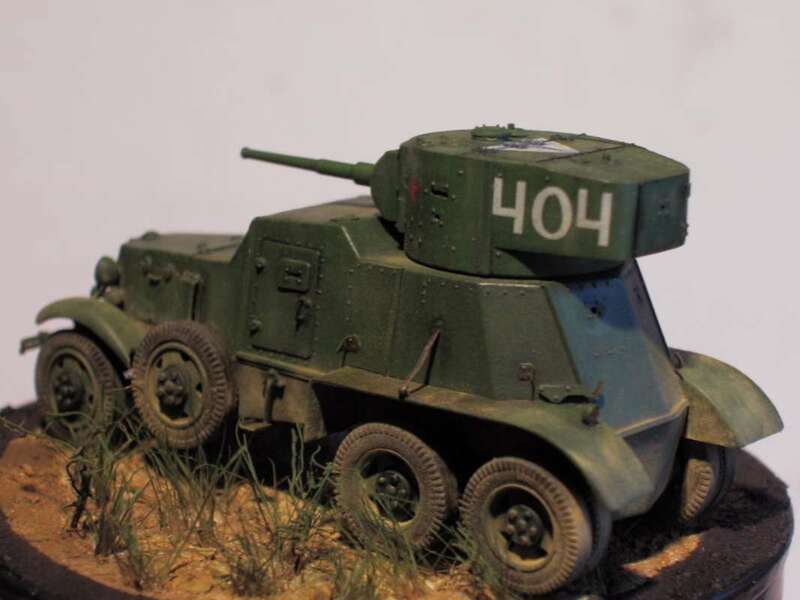 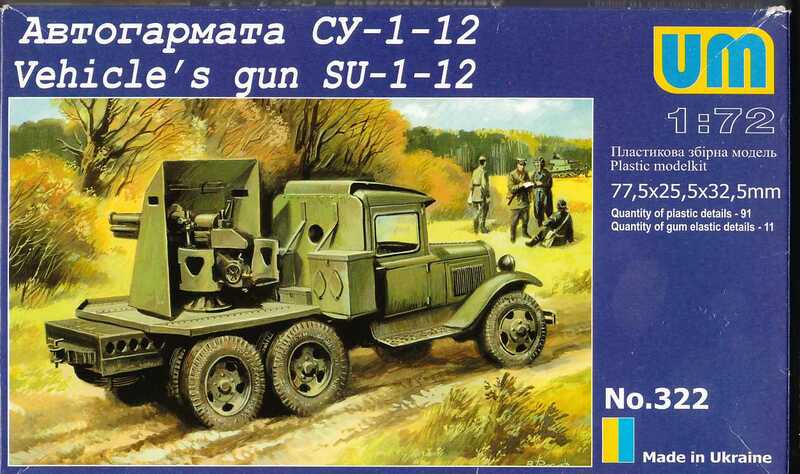 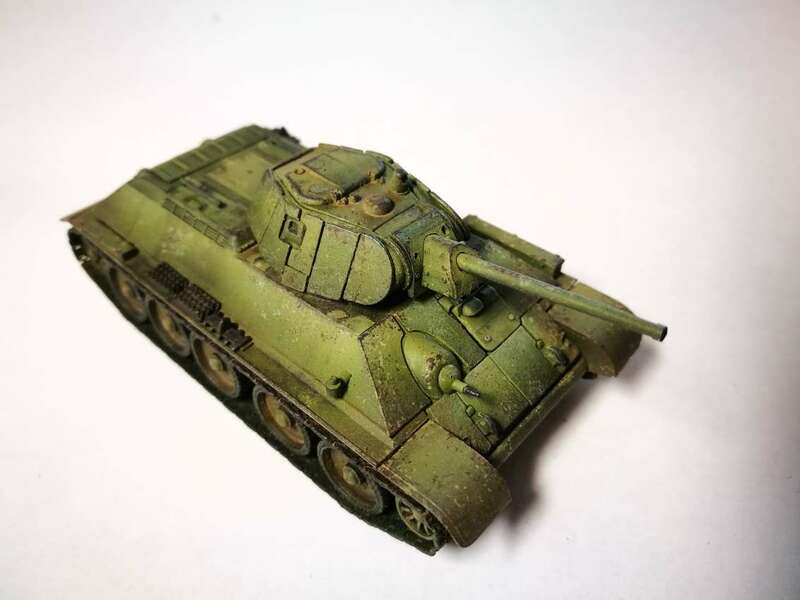 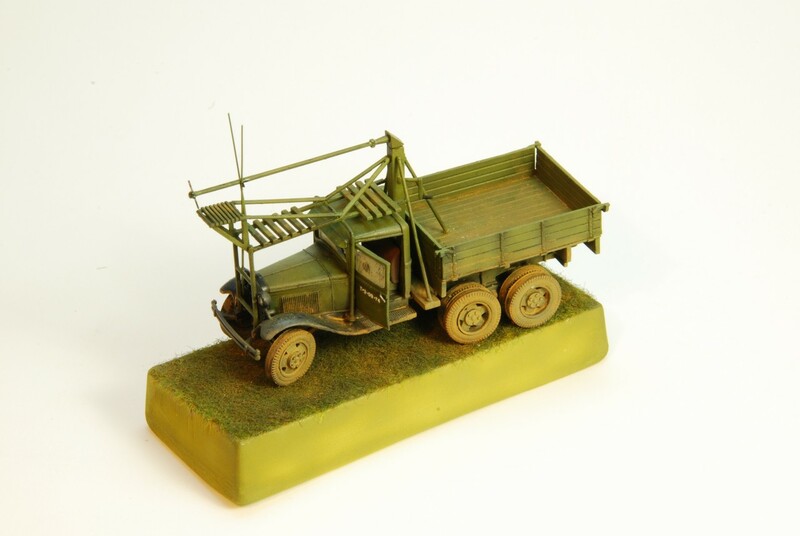 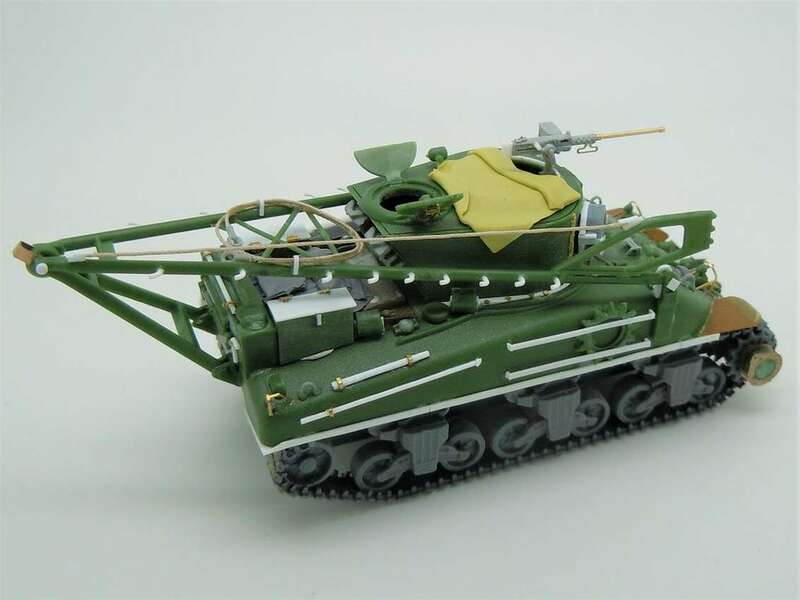 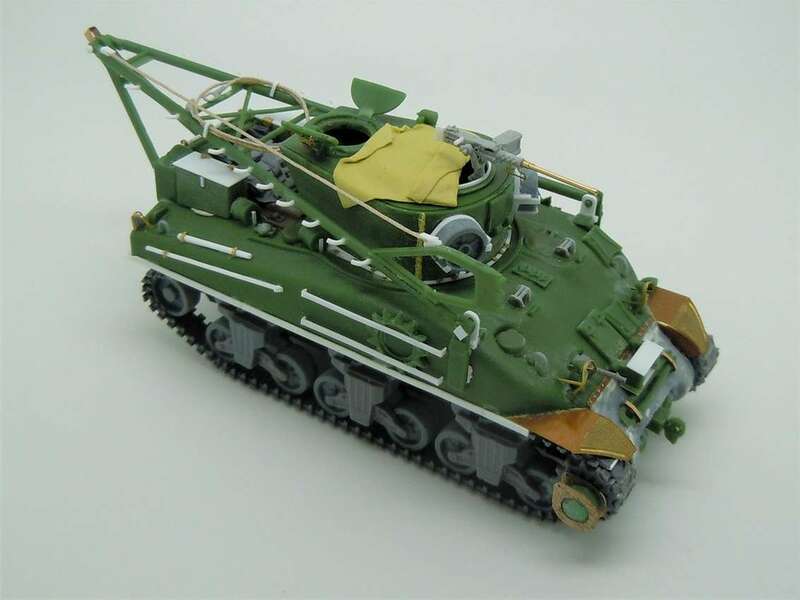 There are 78 ( 57 of them are 'common' with the BA-10 kit) crisp, clean, injection moulded parts, 12 rubber tyres and a set of decals with markings for two Soviet vehicles (one from 1938, the other...1943). 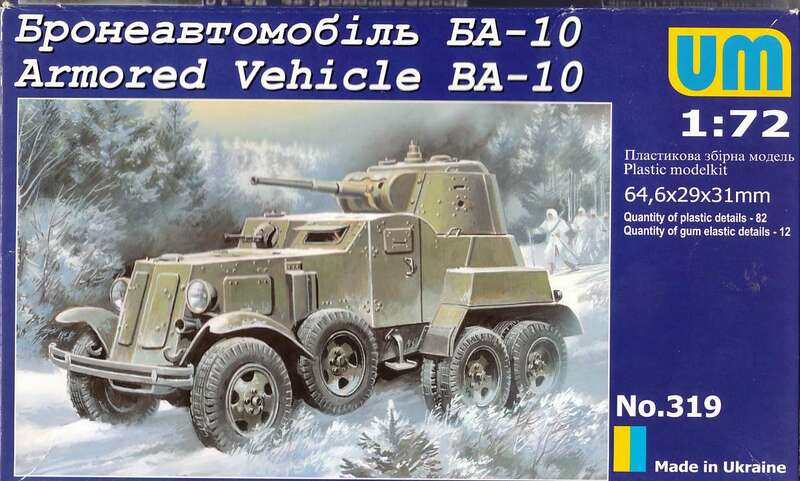 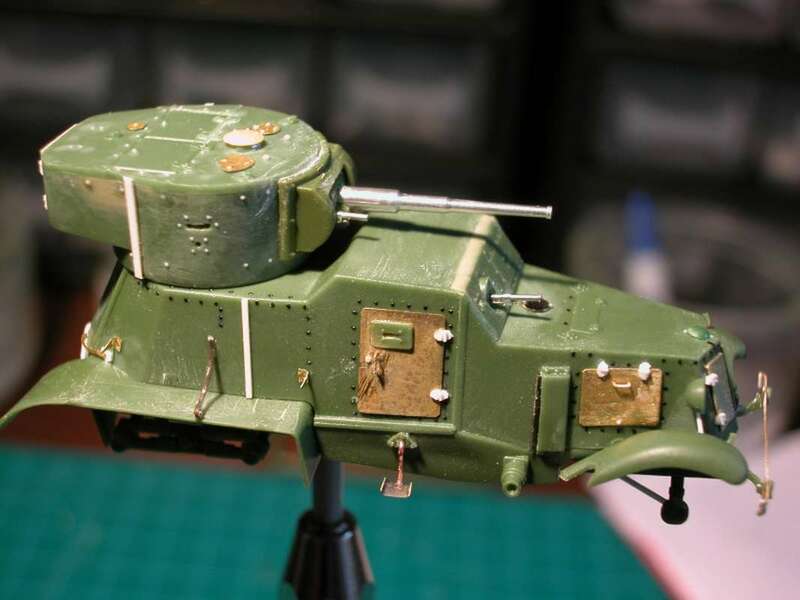 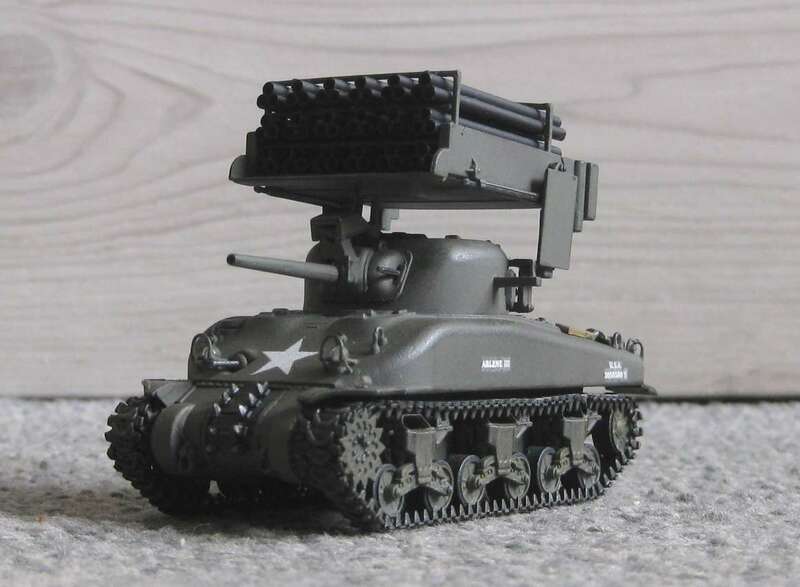 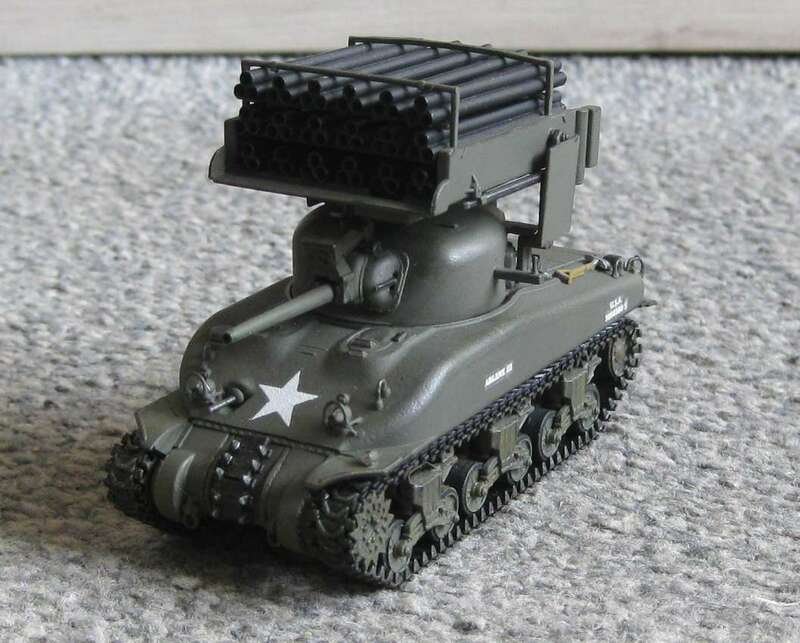 As with the BA-10, there is no interior detail nor optional position doors or hatches but the turret is moveable and the underside has reasonable detail. 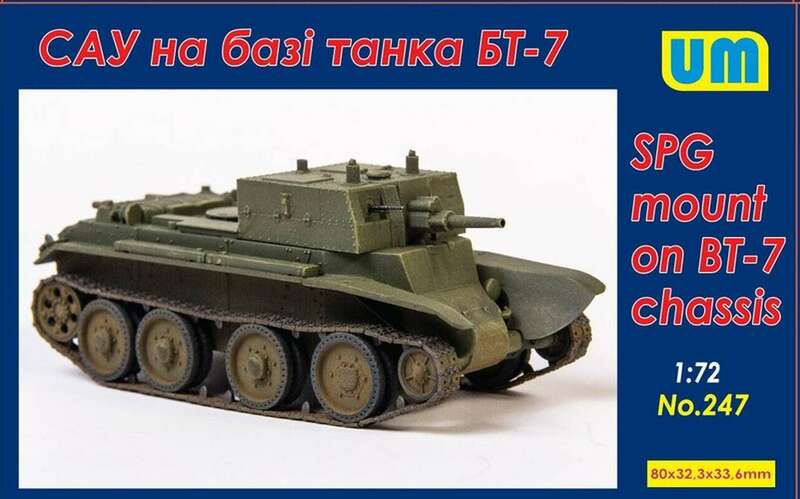 This is just a re-issue of the BA-6, with a couple of detail changes to the upper body shell...so minor they are hard to notice! 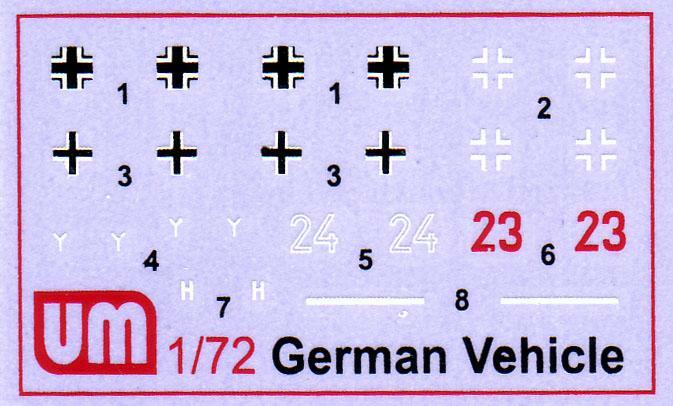 The new decal sheet has markings for two vehicles...one from 1935, the other from 1941. 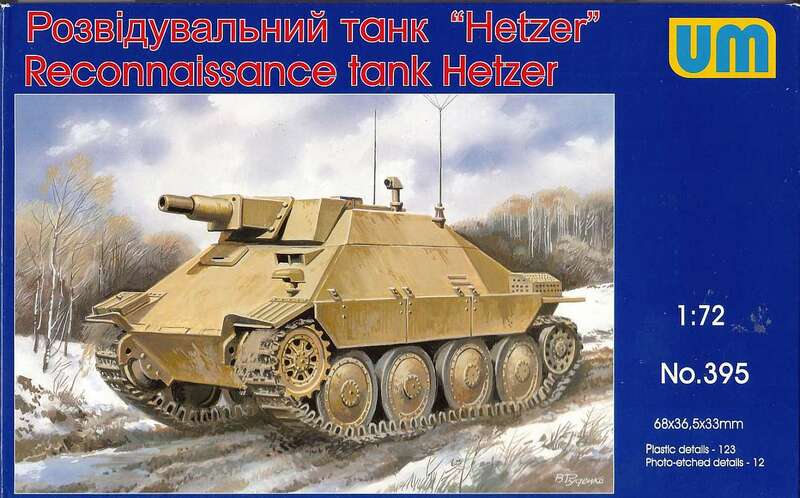 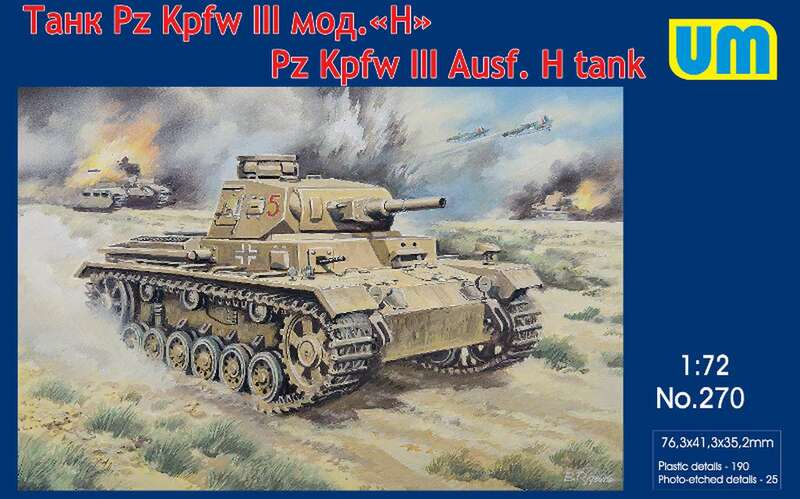 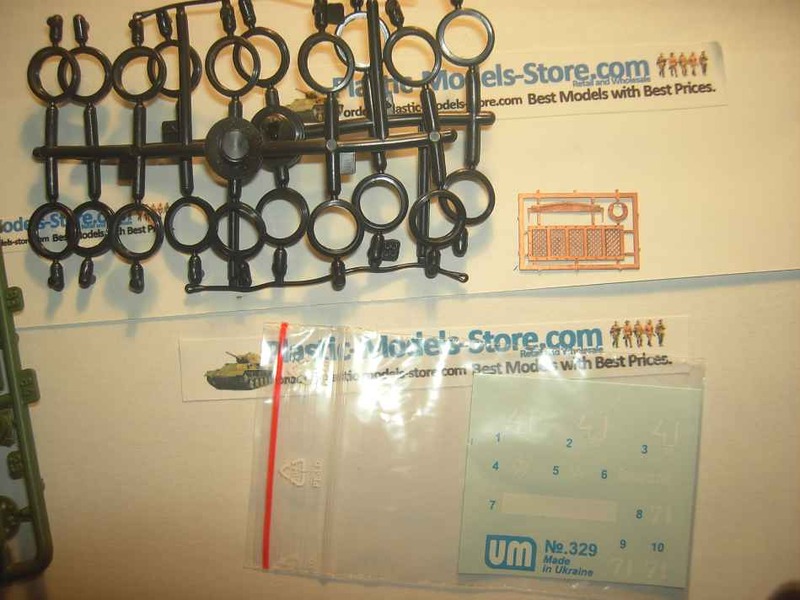 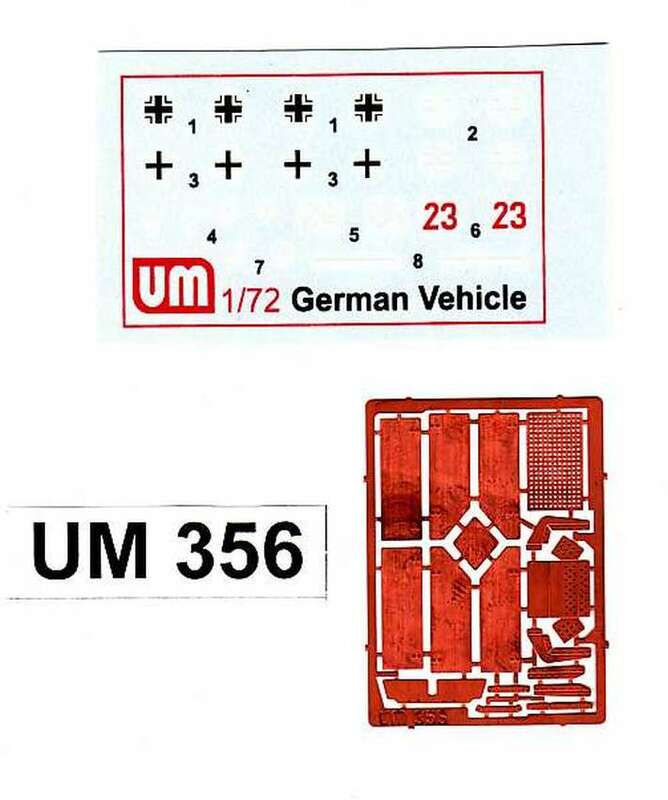 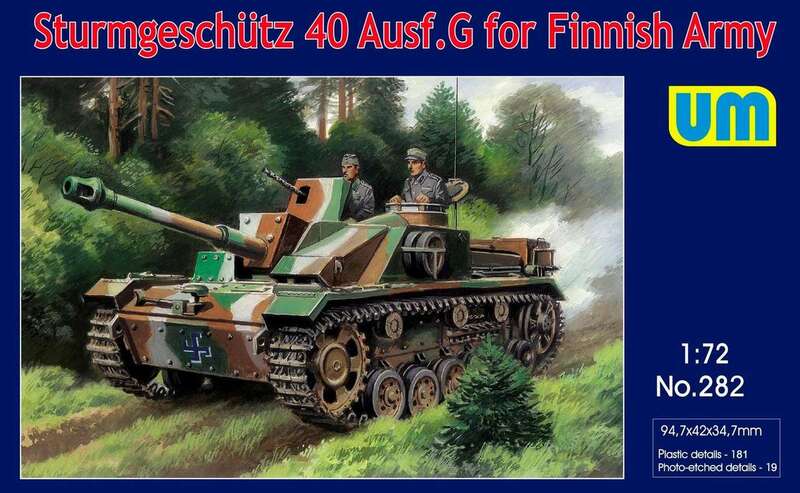 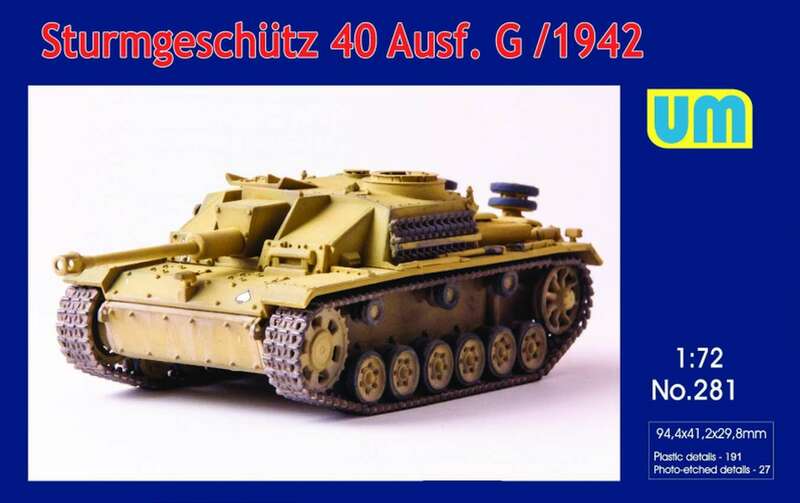 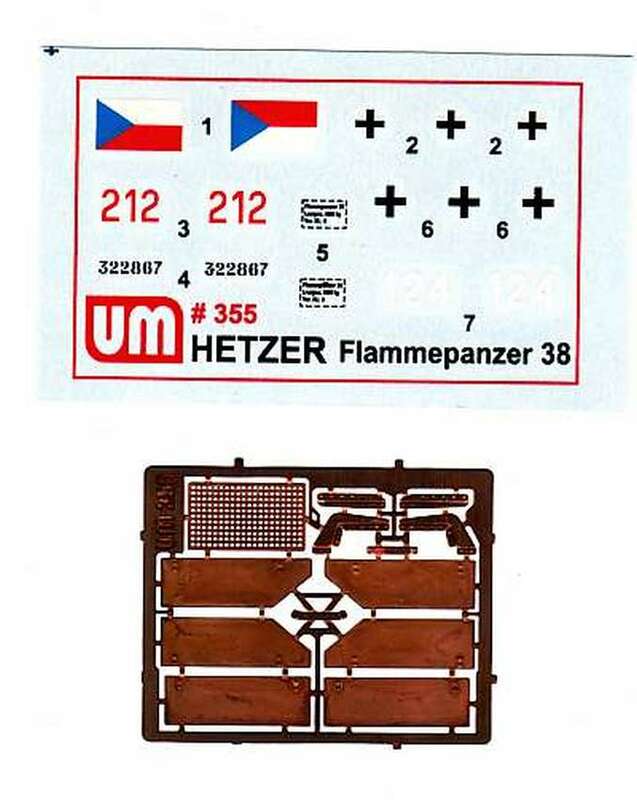 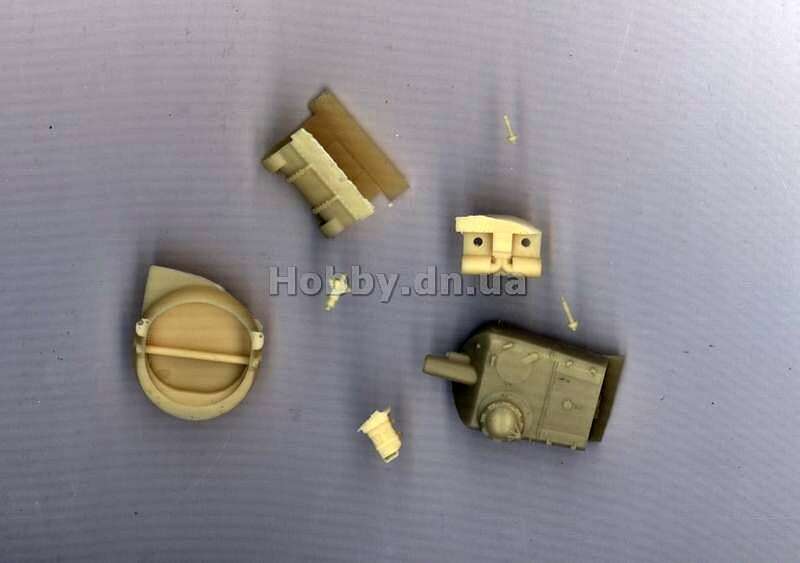 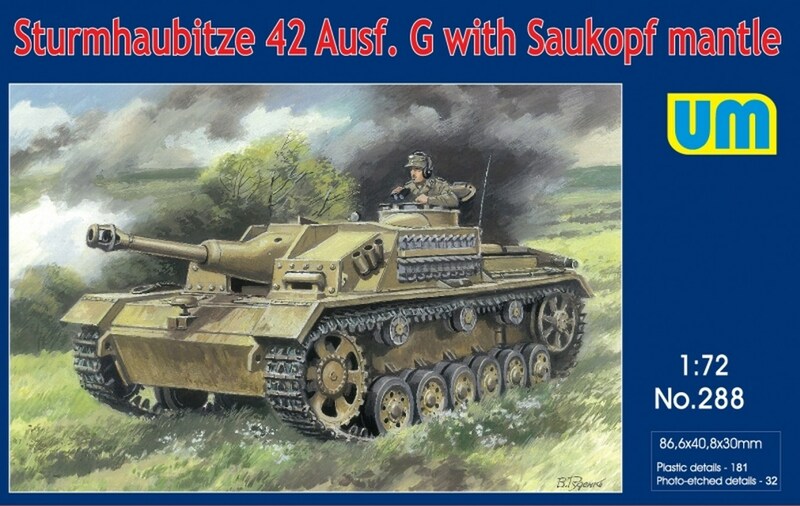 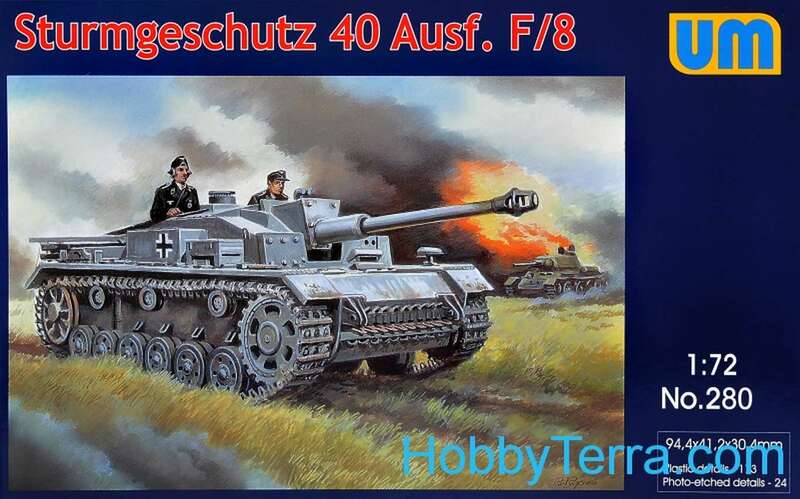 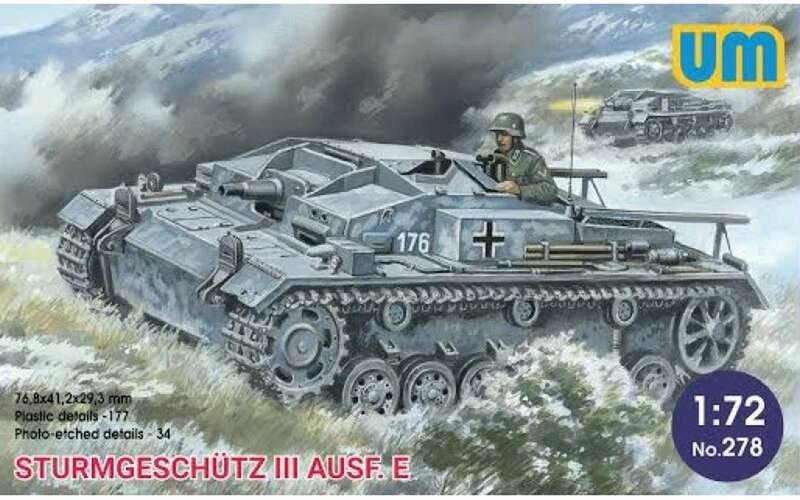 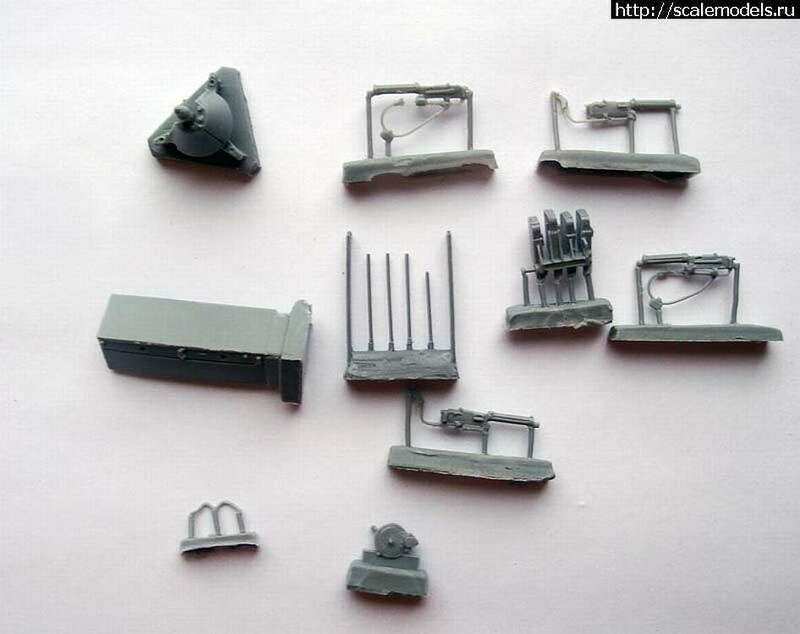 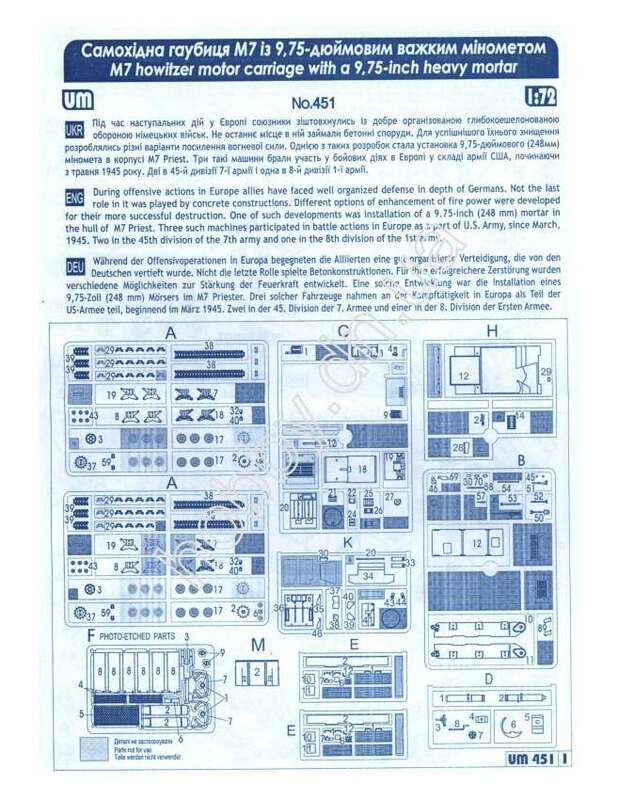 Kit um358 - Hetzer "Starr"
Kit um368 - T34/76 "Screened"
Kit um376 - Sherman Medium tank "Calliope"
Kit um395 - Aufklarungspanzer 38 "Hetzer"
I ordered the latest UM kit, number 255 - Heavy artillery armored car S.S. from an online shop a while back. 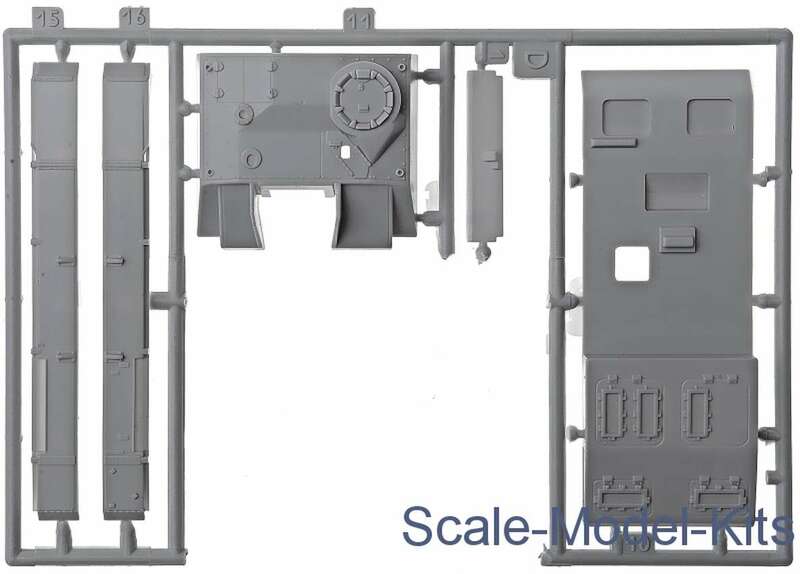 This kit promised to be a step above the not so great resin kit of the similar Planet Schw. 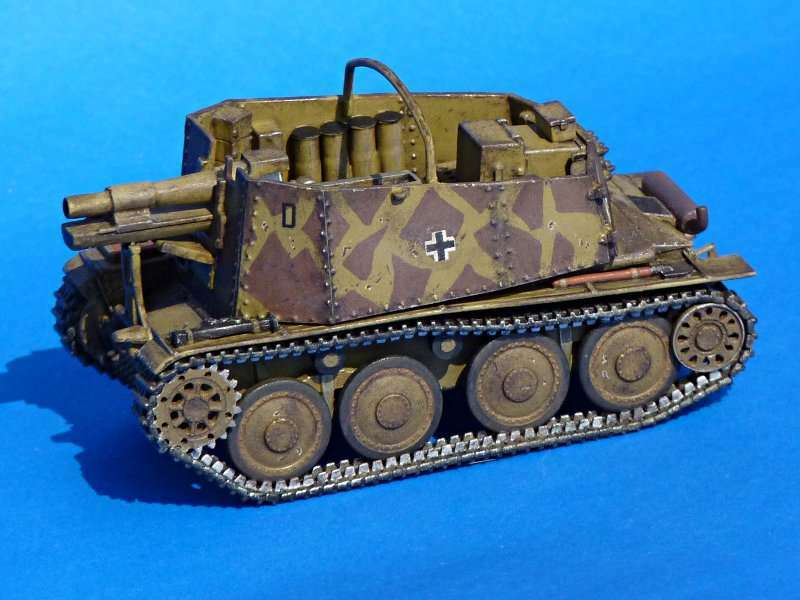 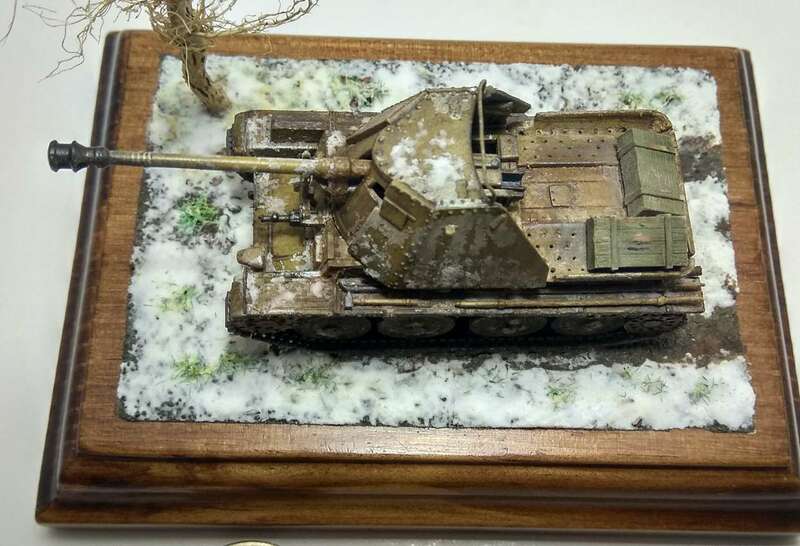 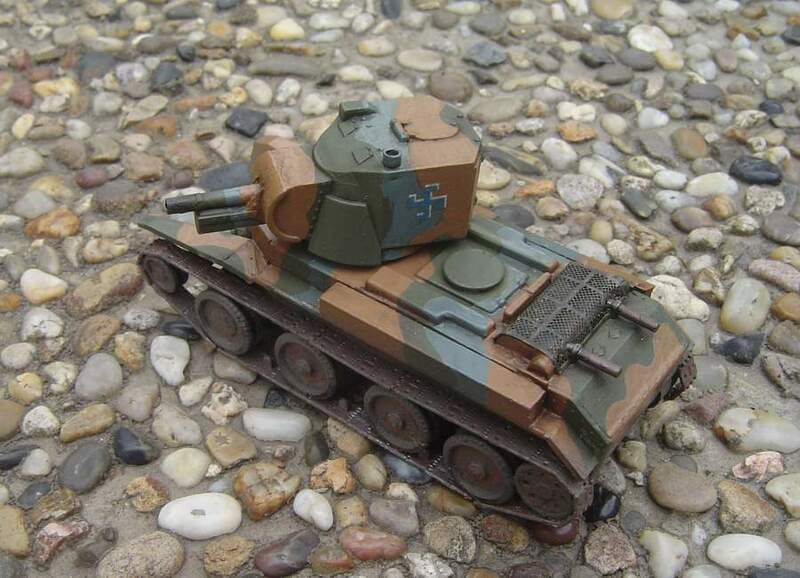 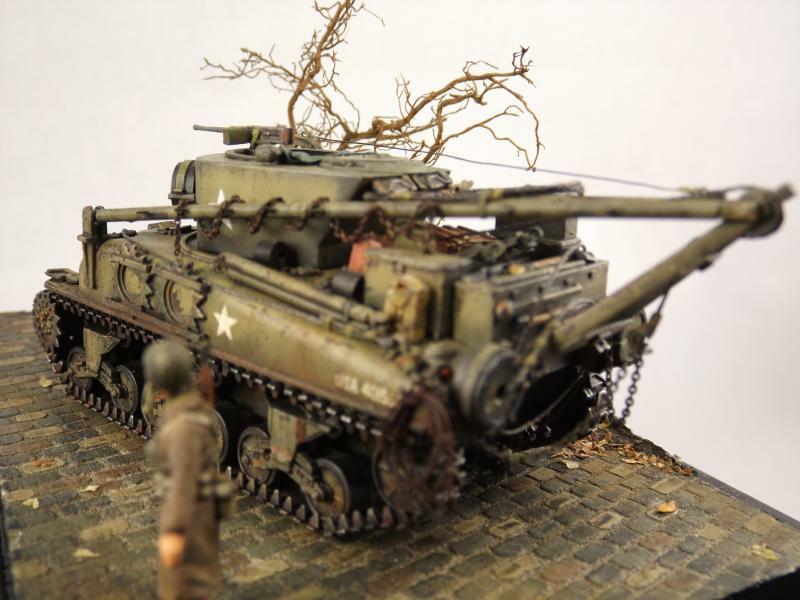 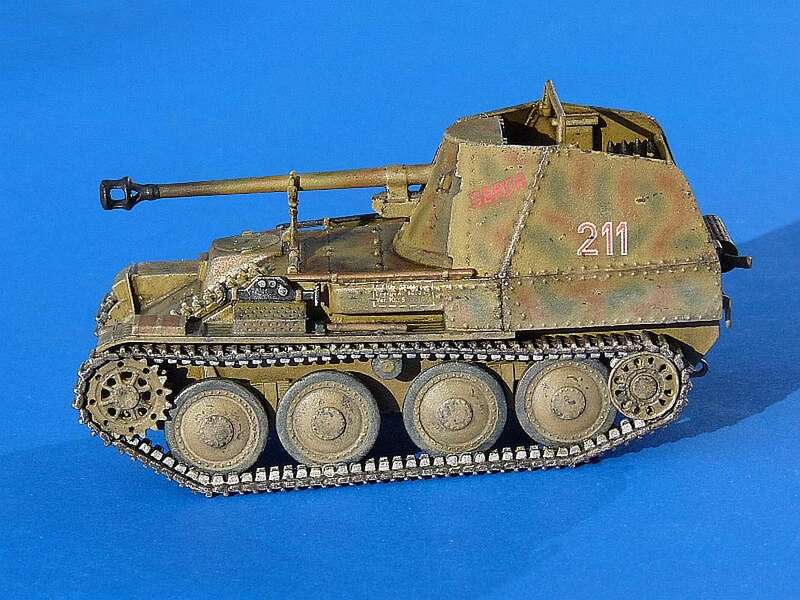 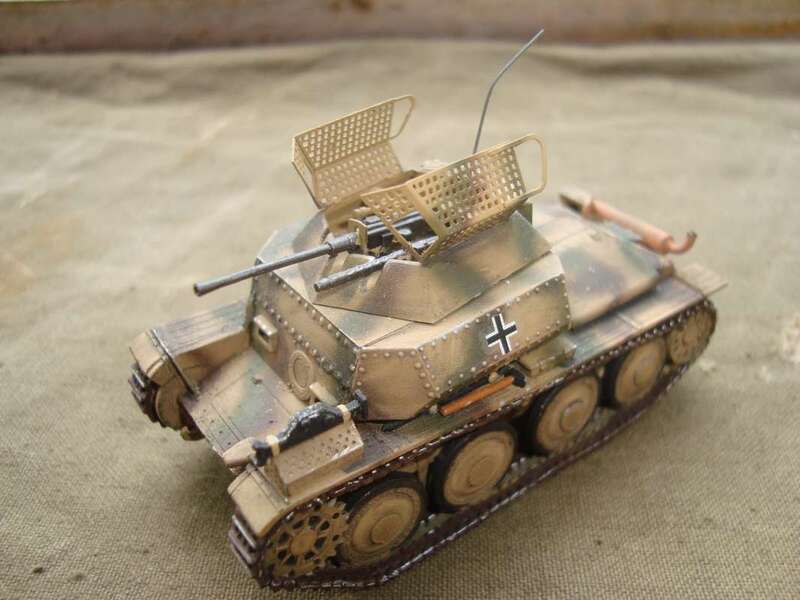 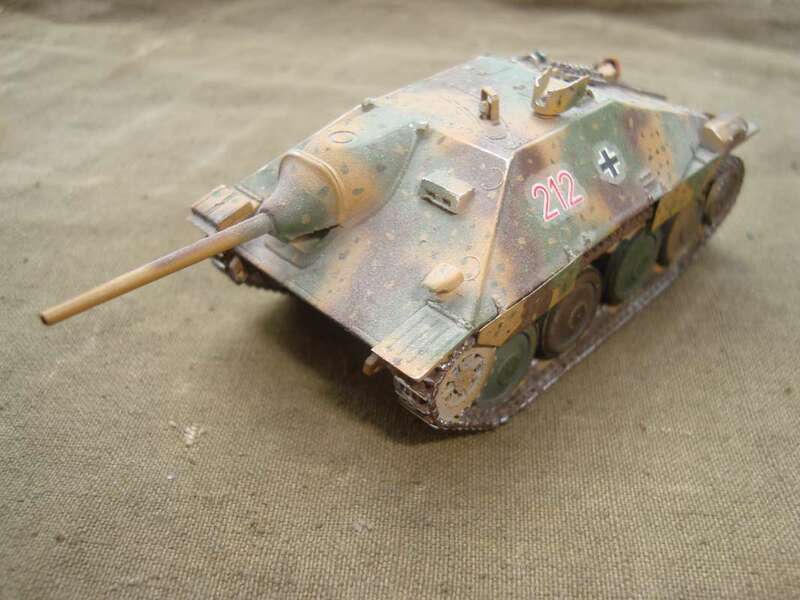 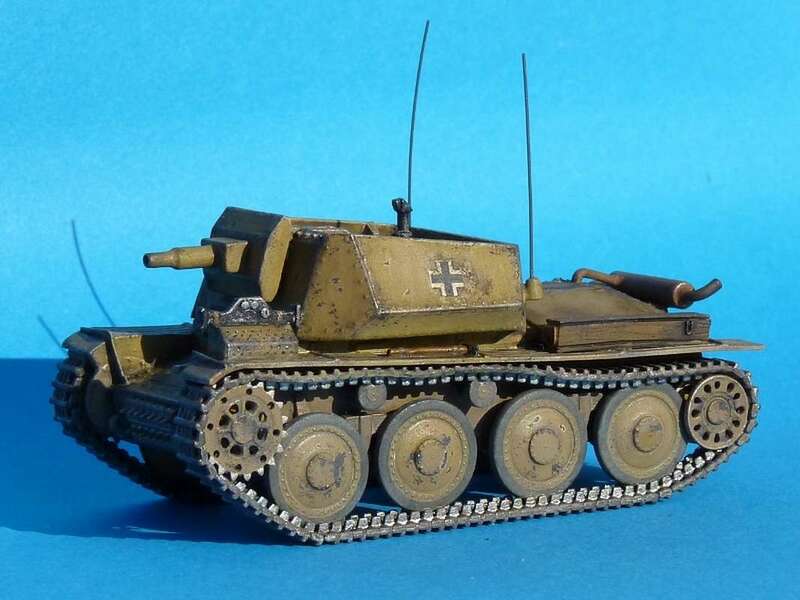 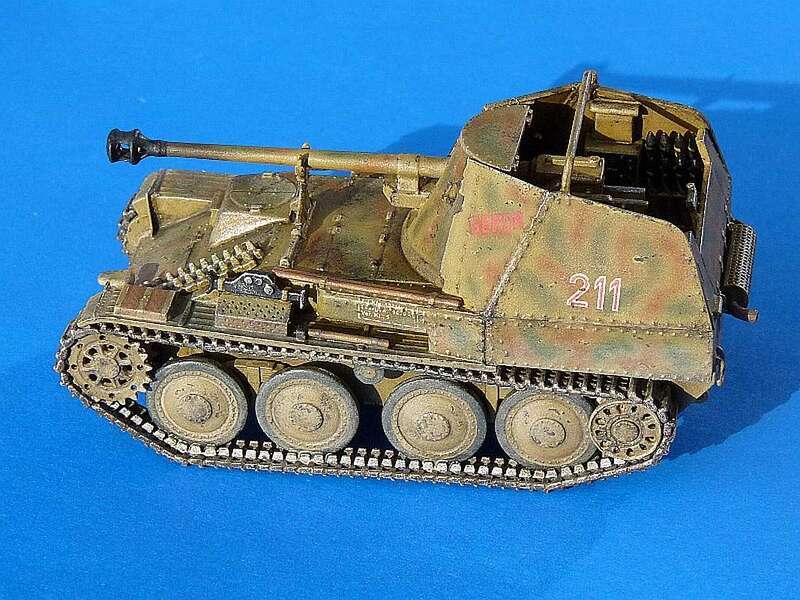 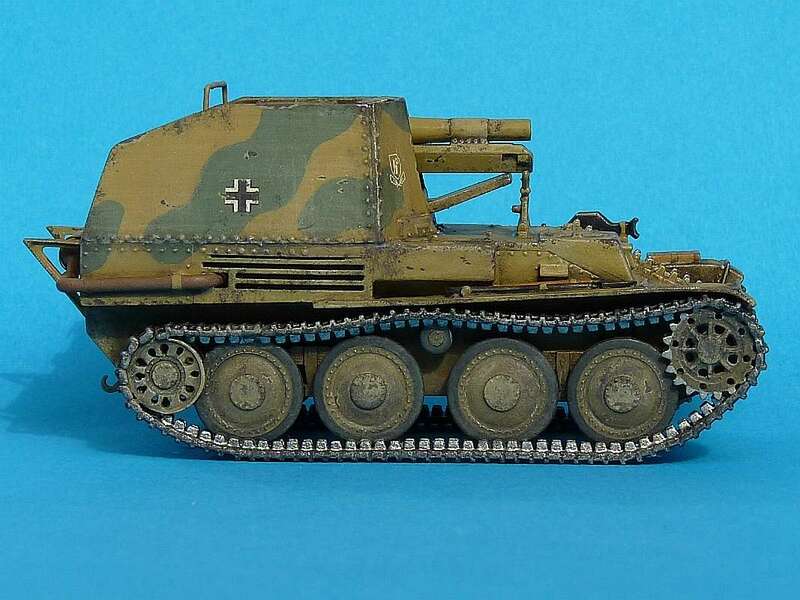 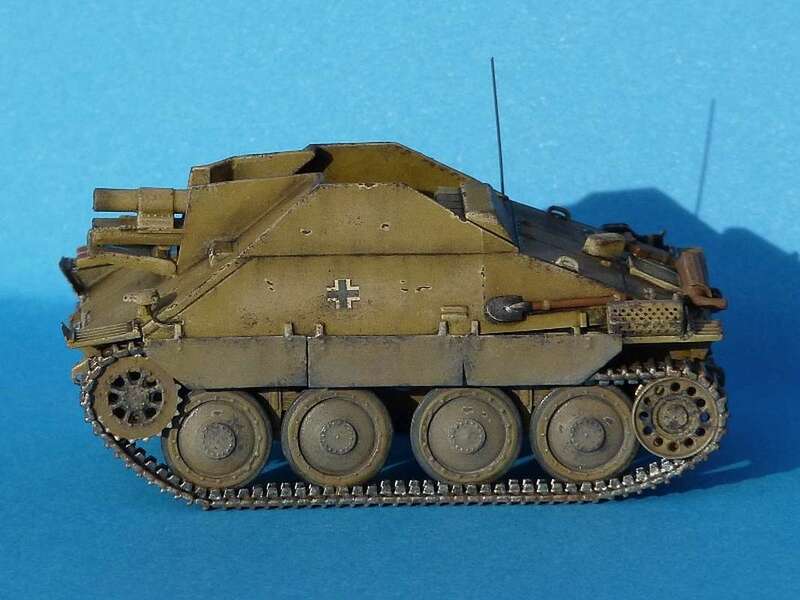 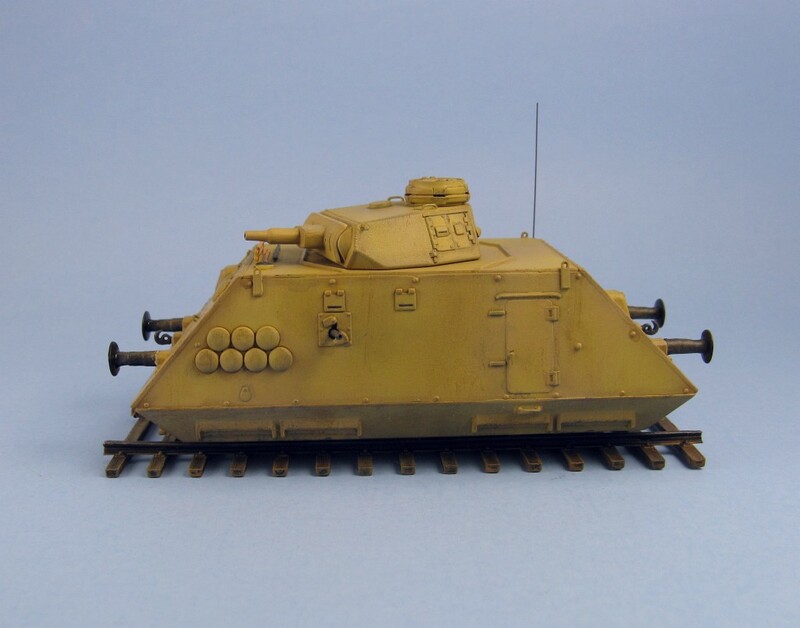 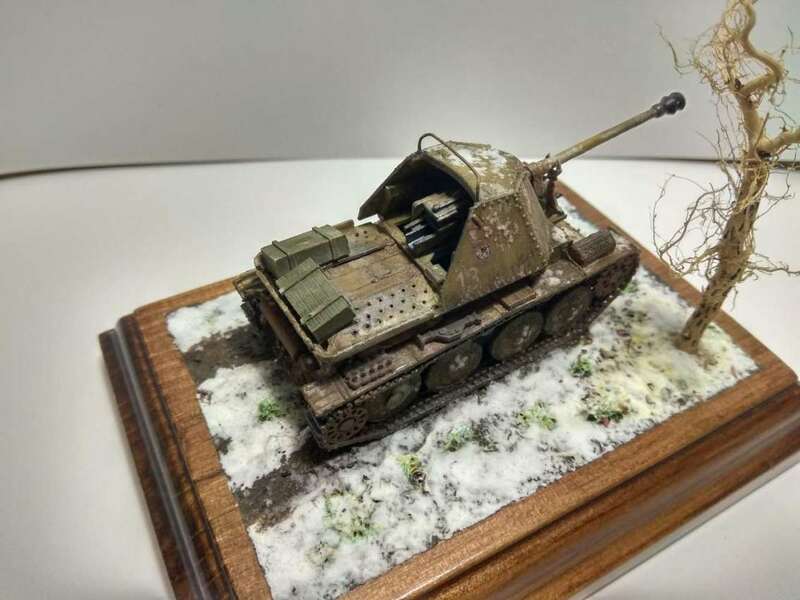 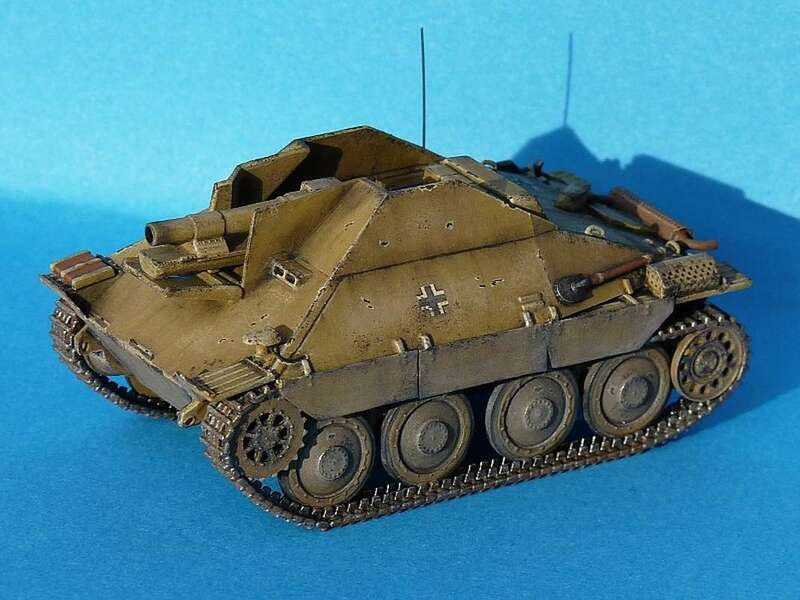 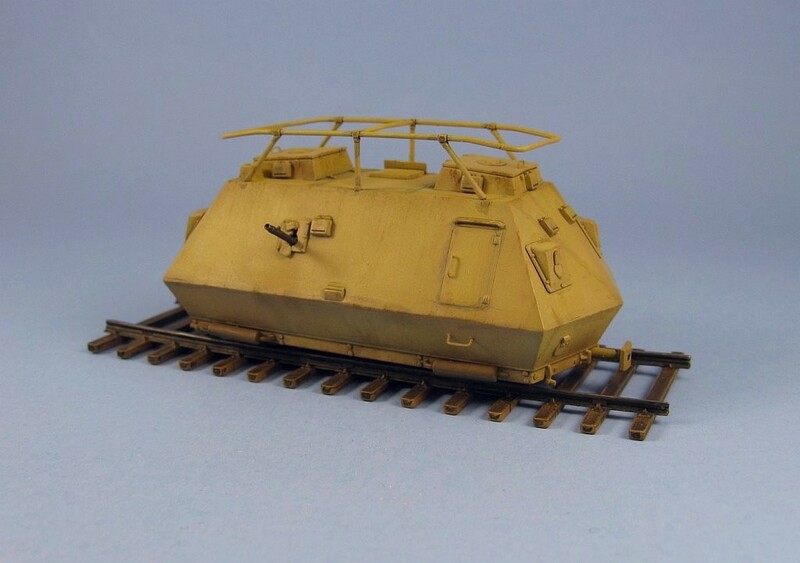 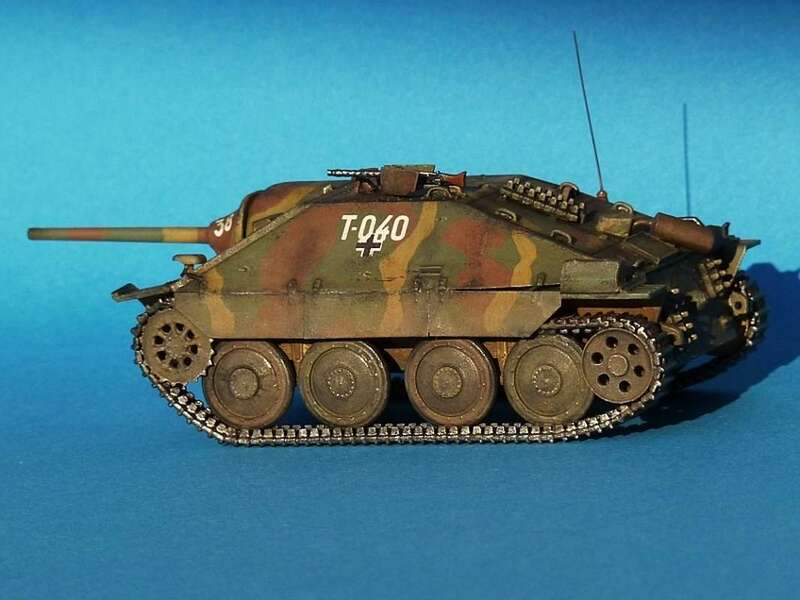 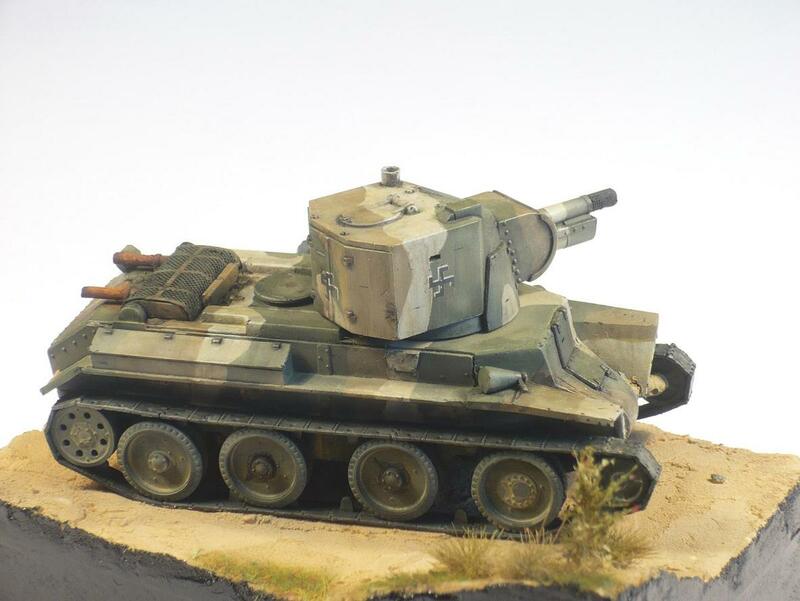 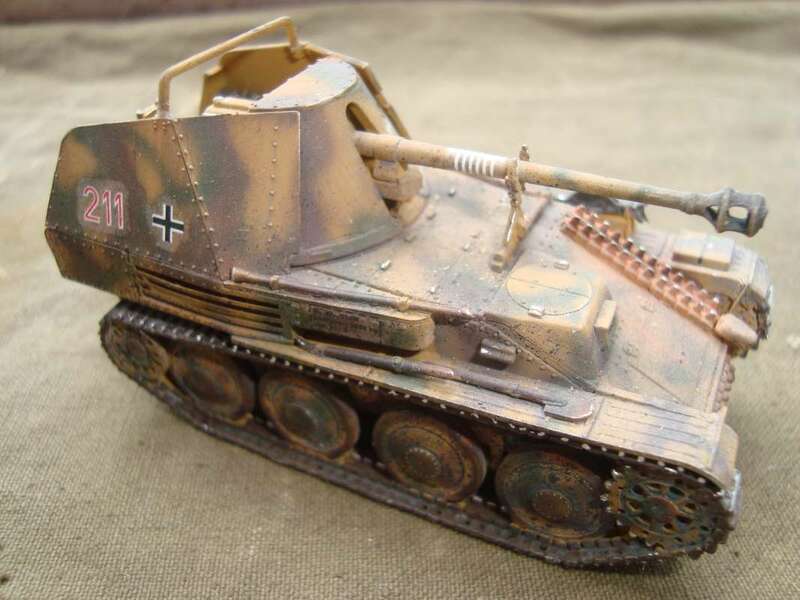 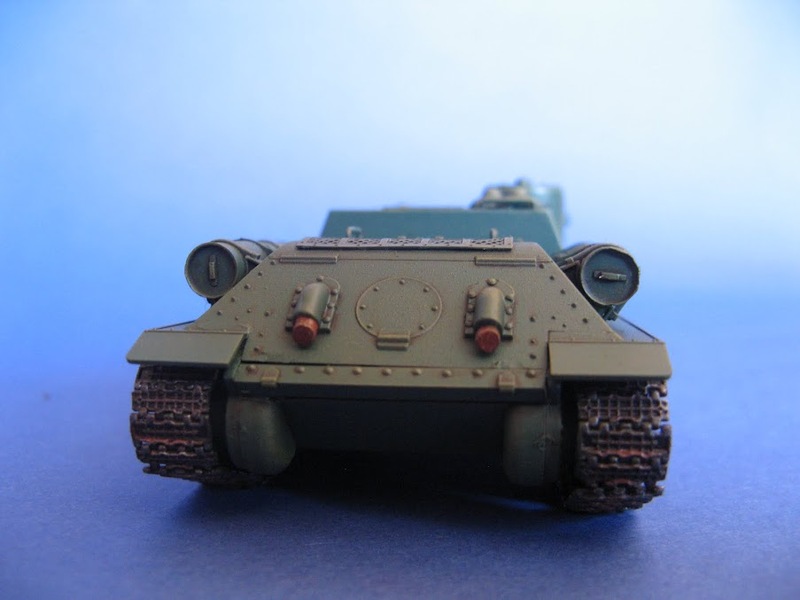 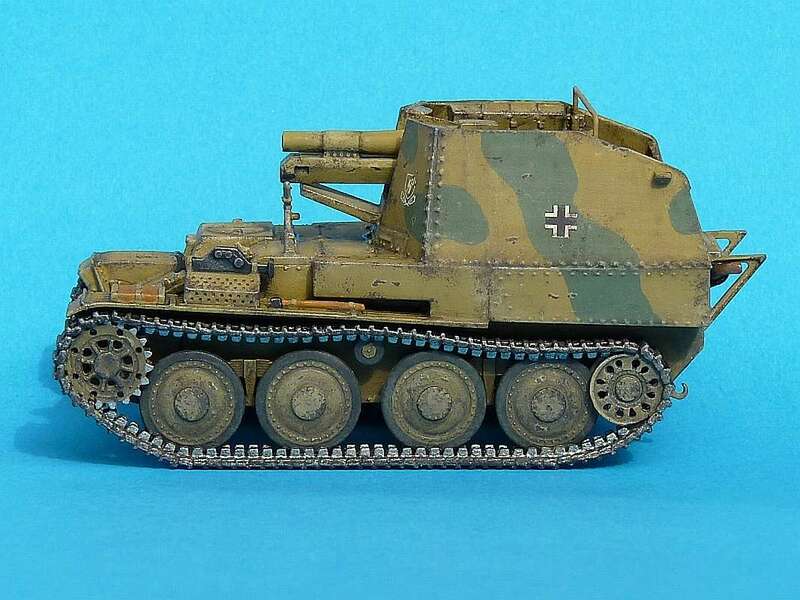 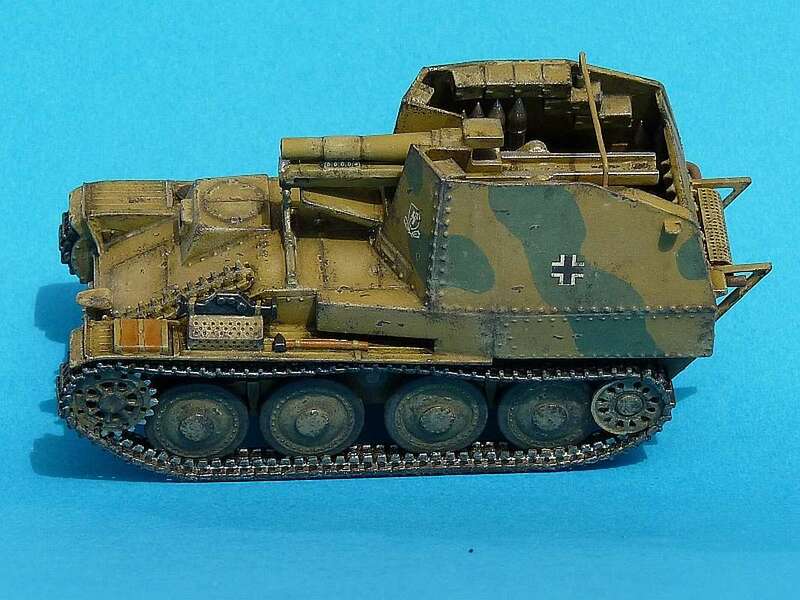 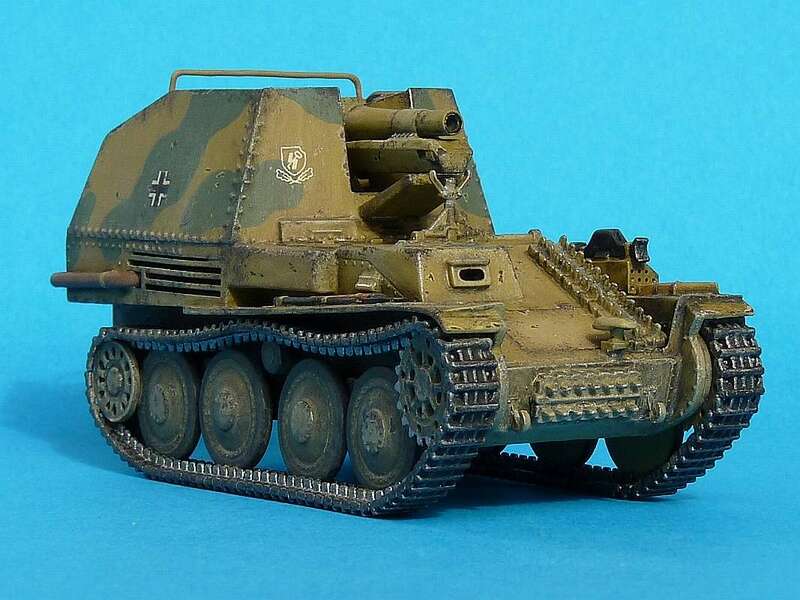 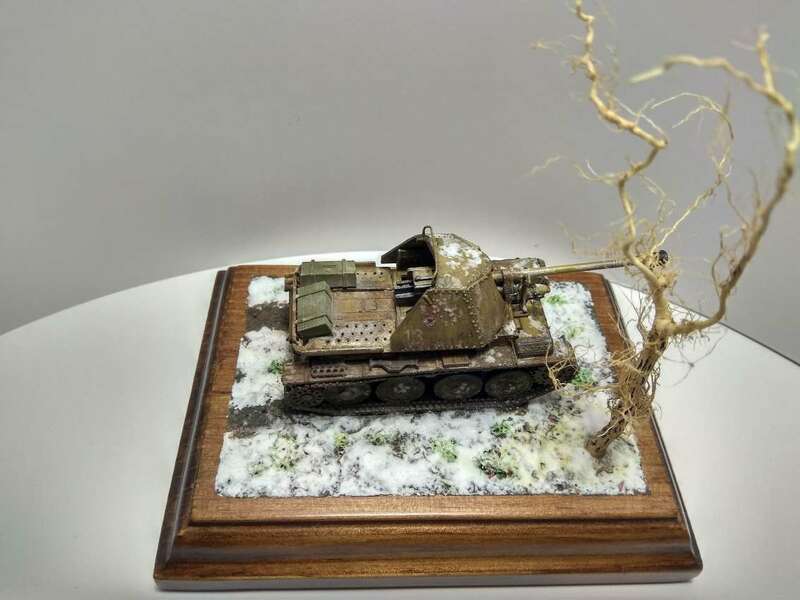 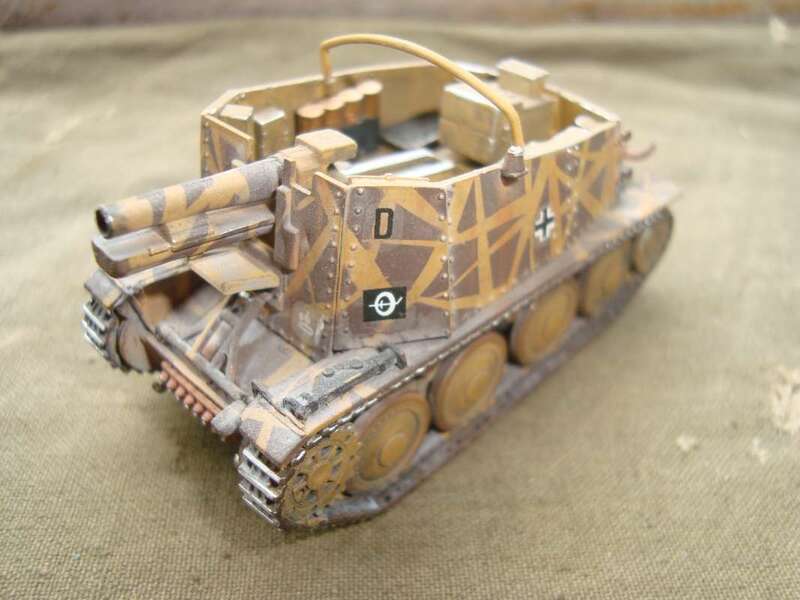 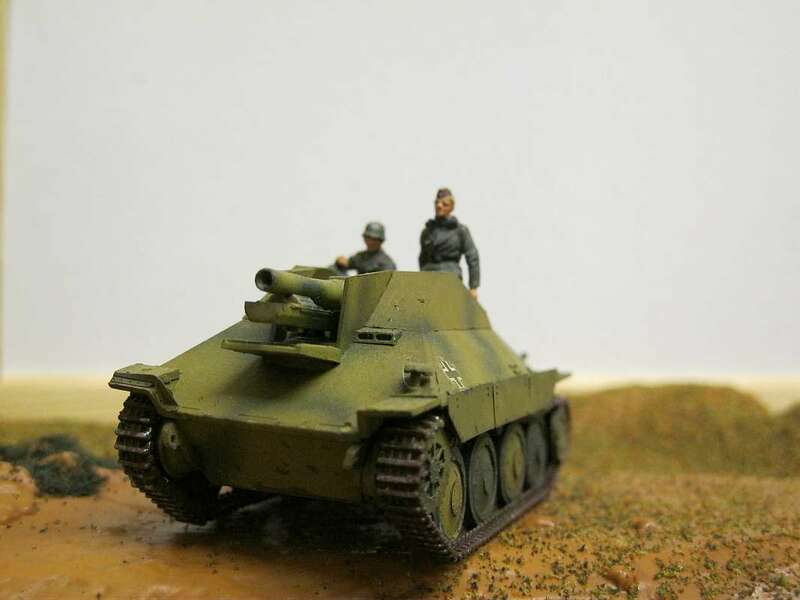 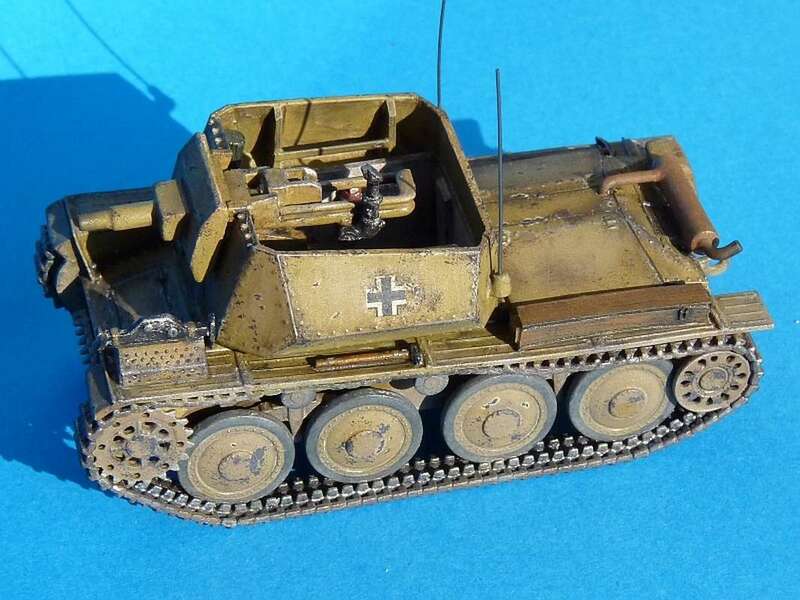 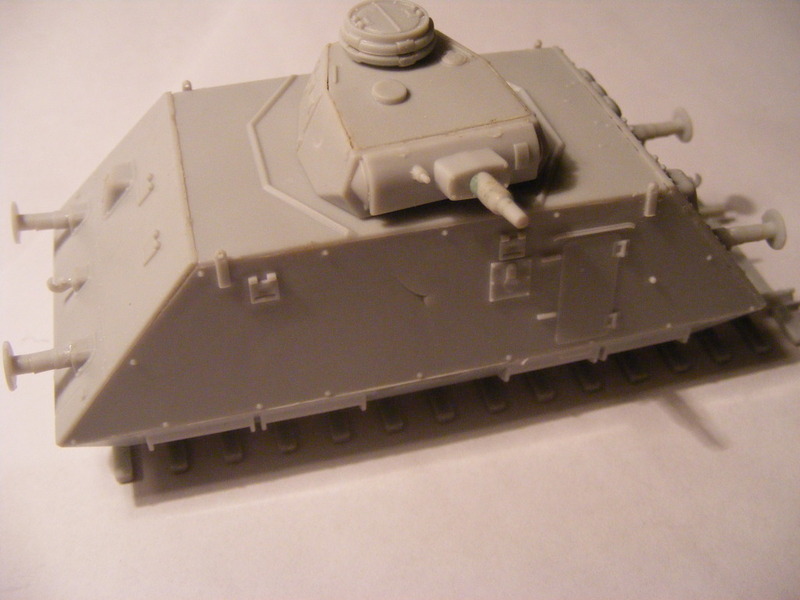 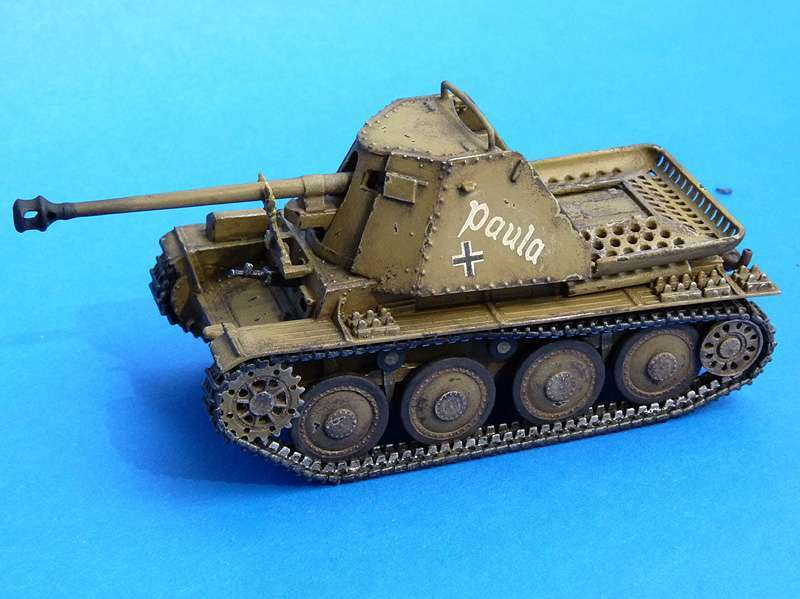 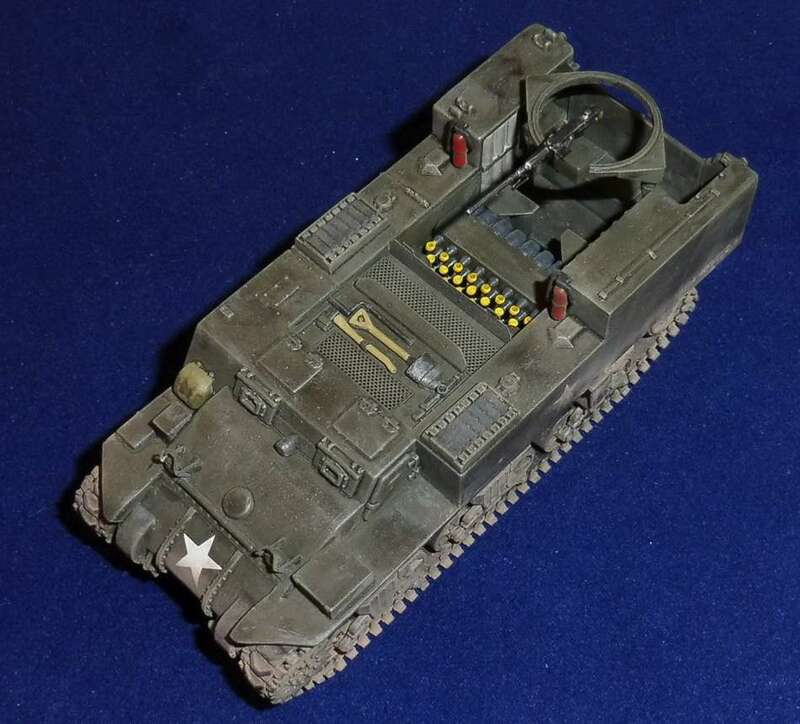 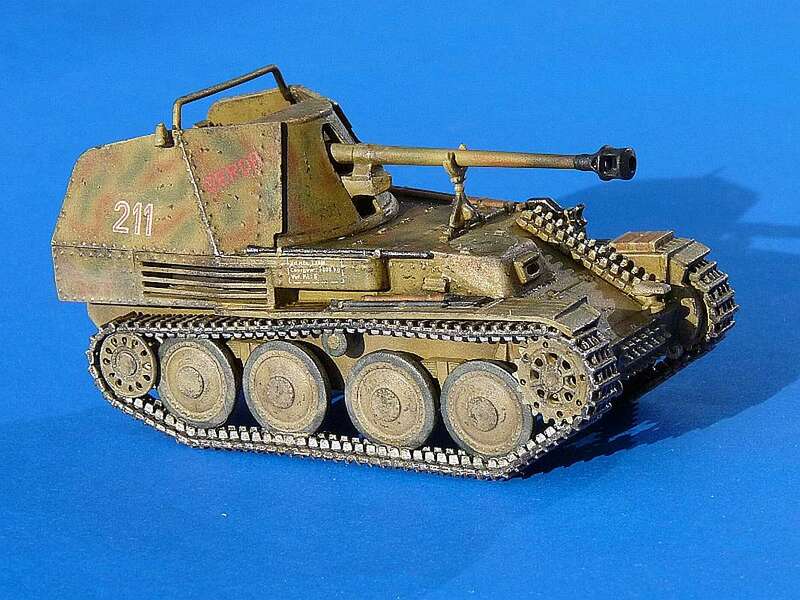 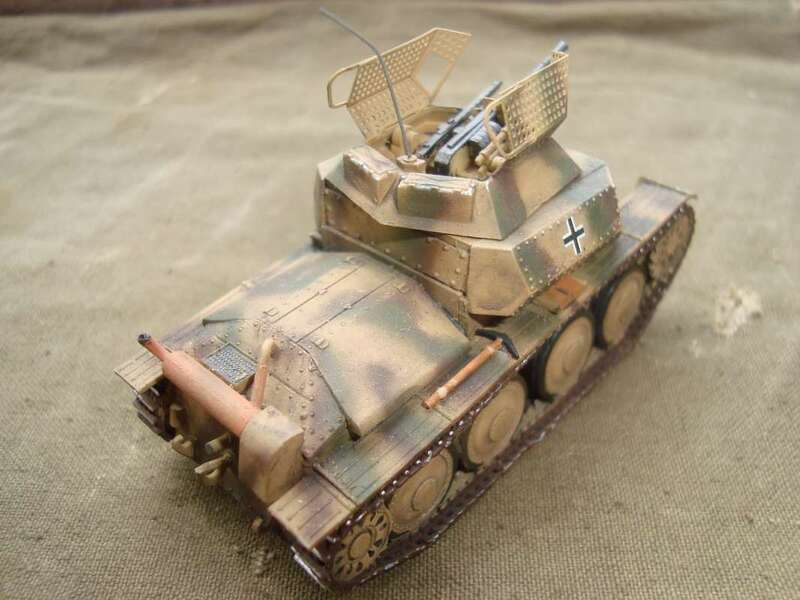 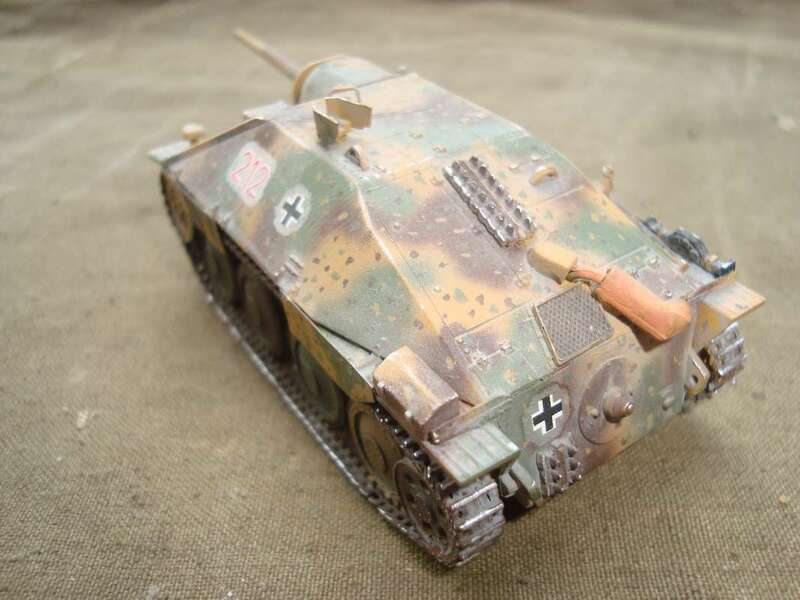 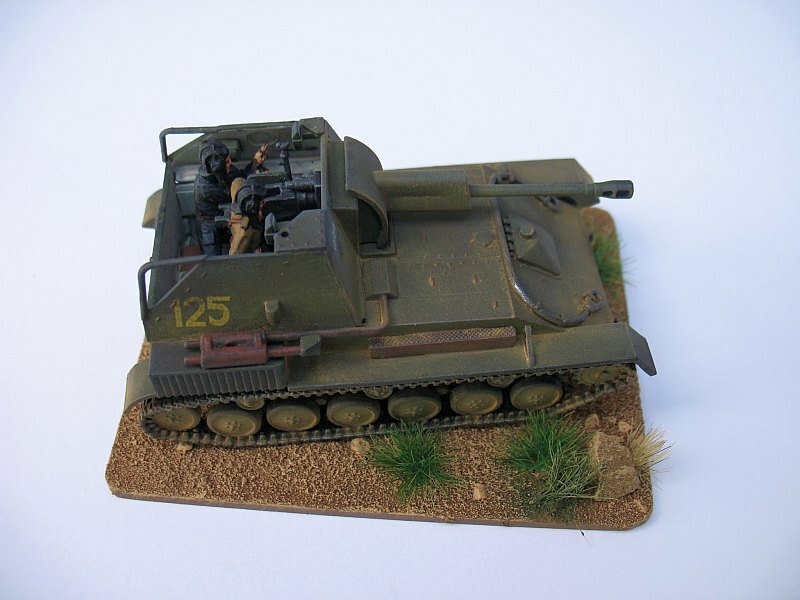 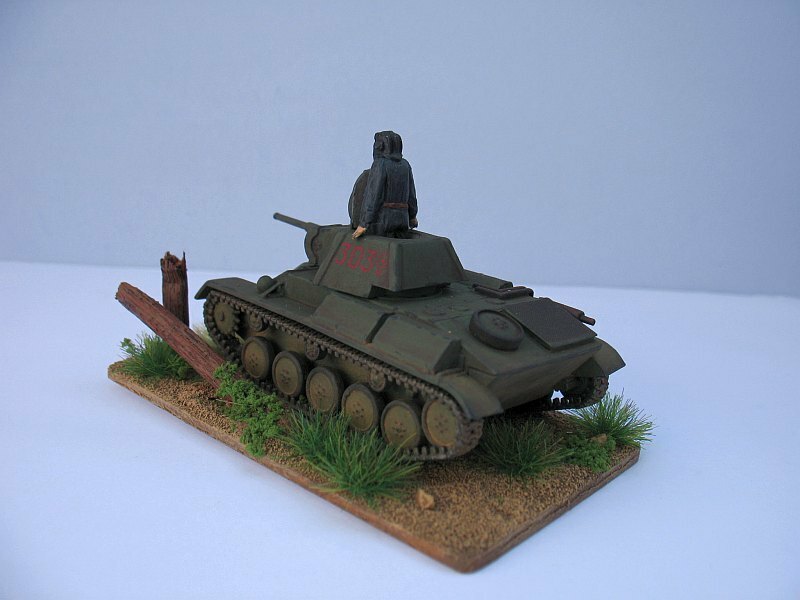 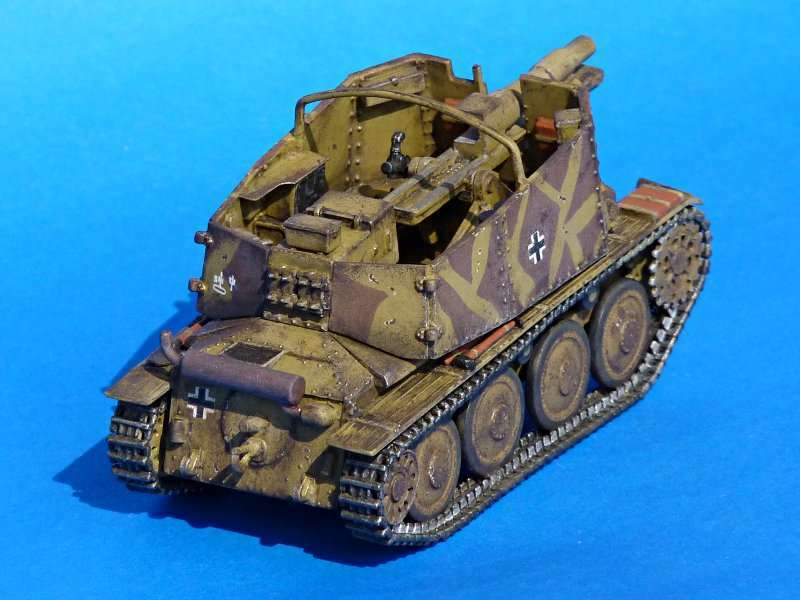 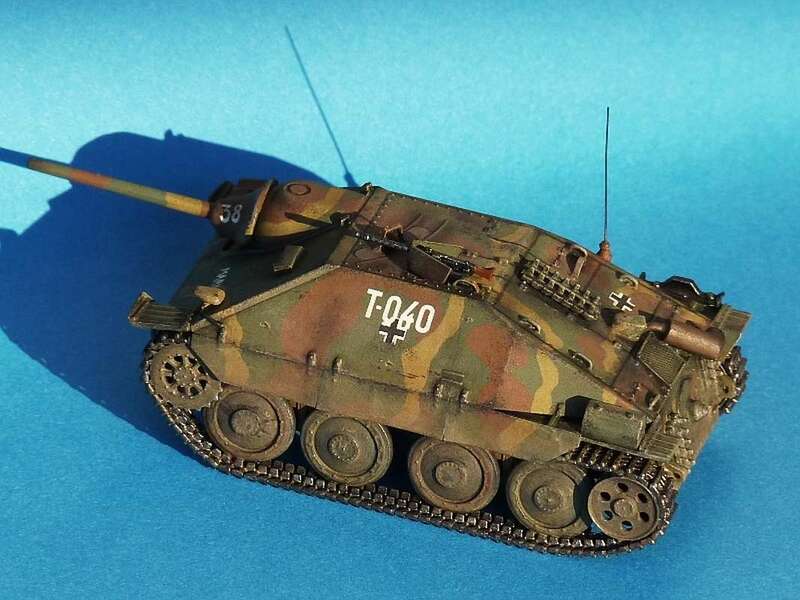 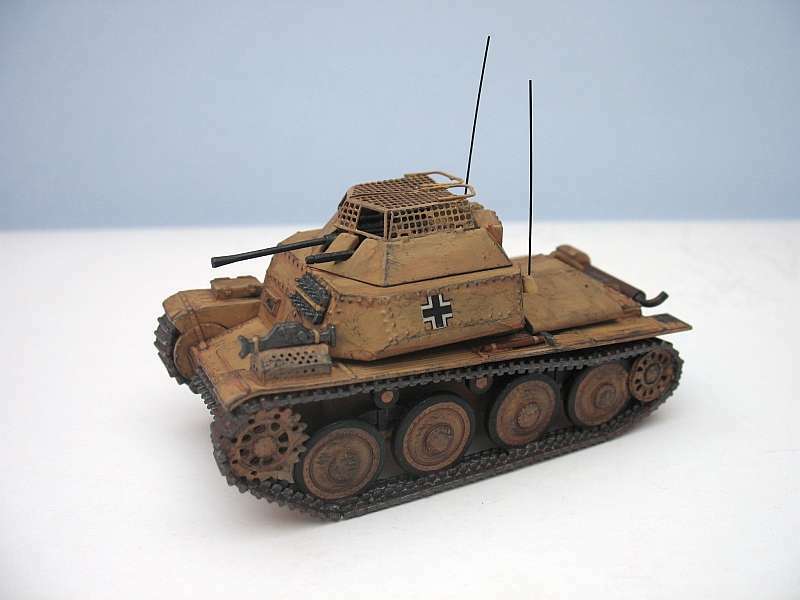 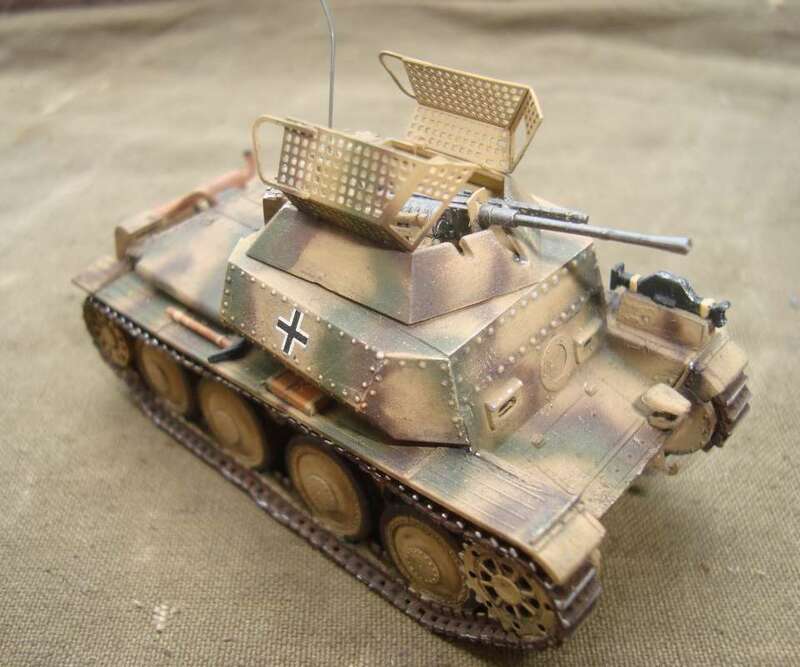 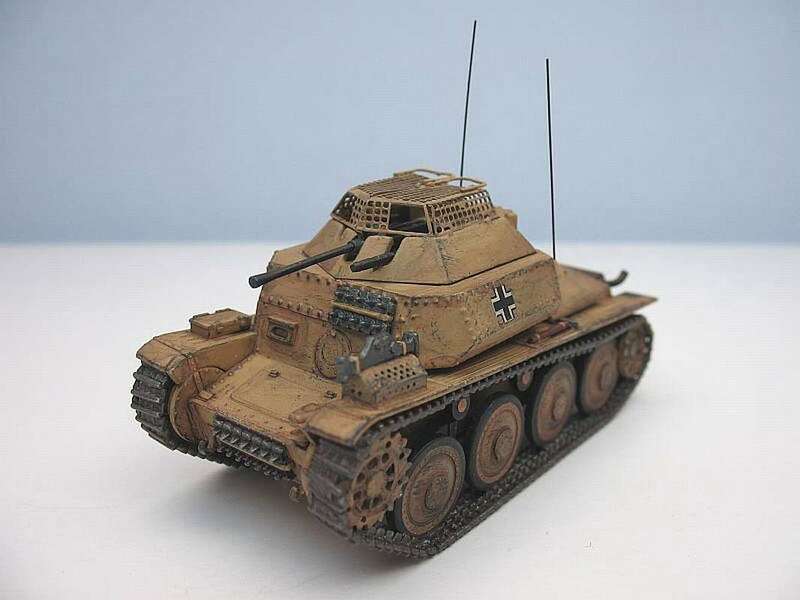 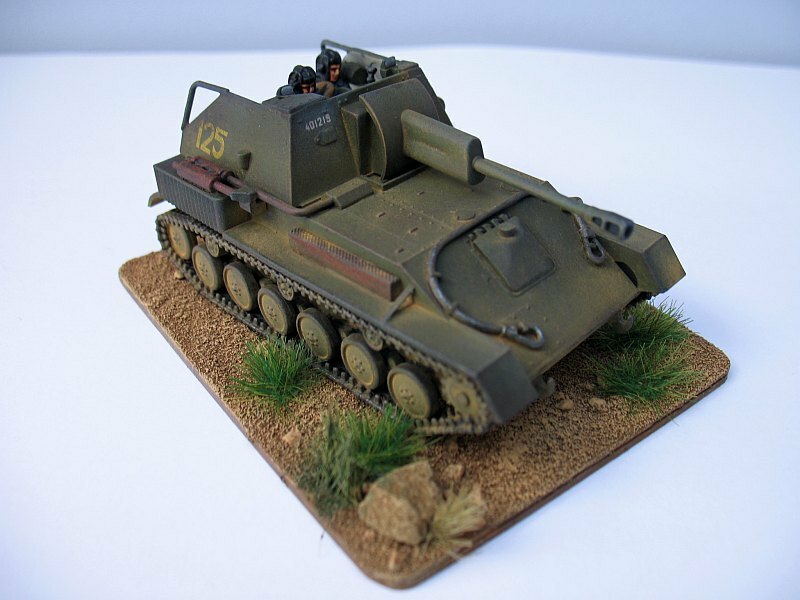 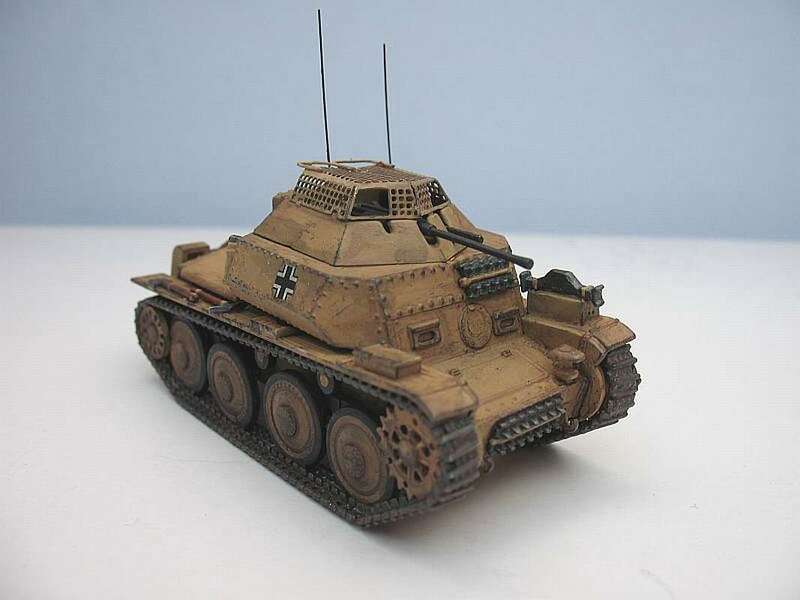 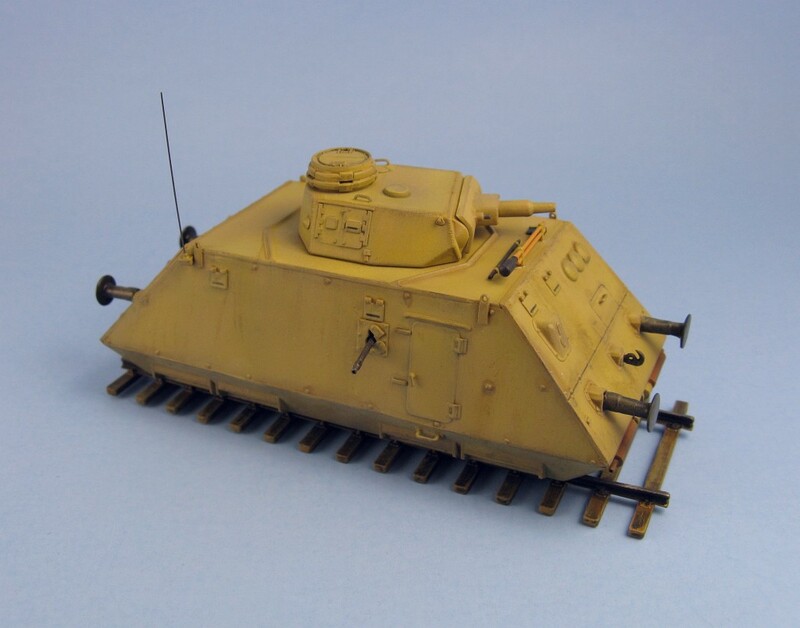 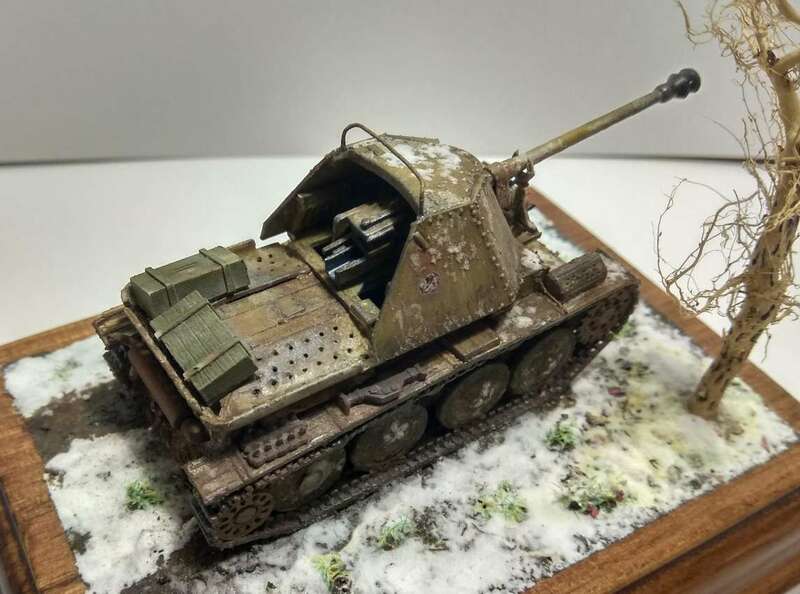 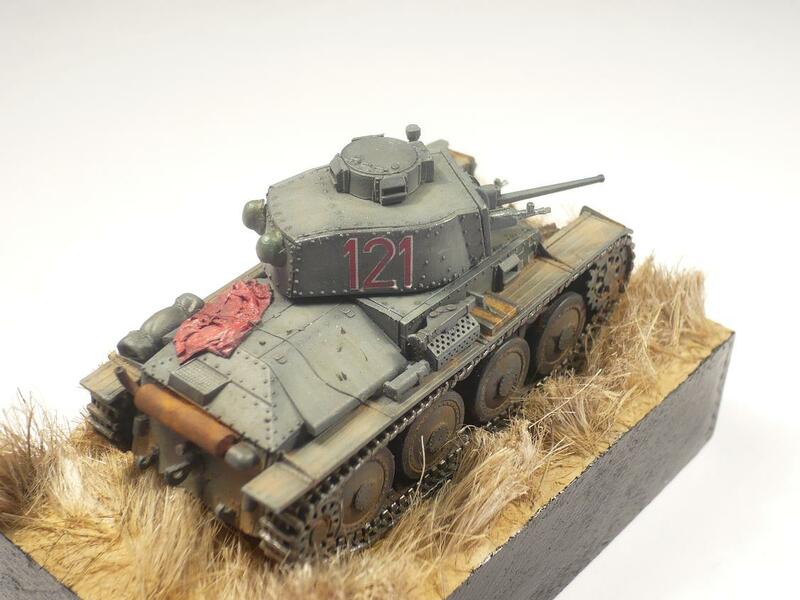 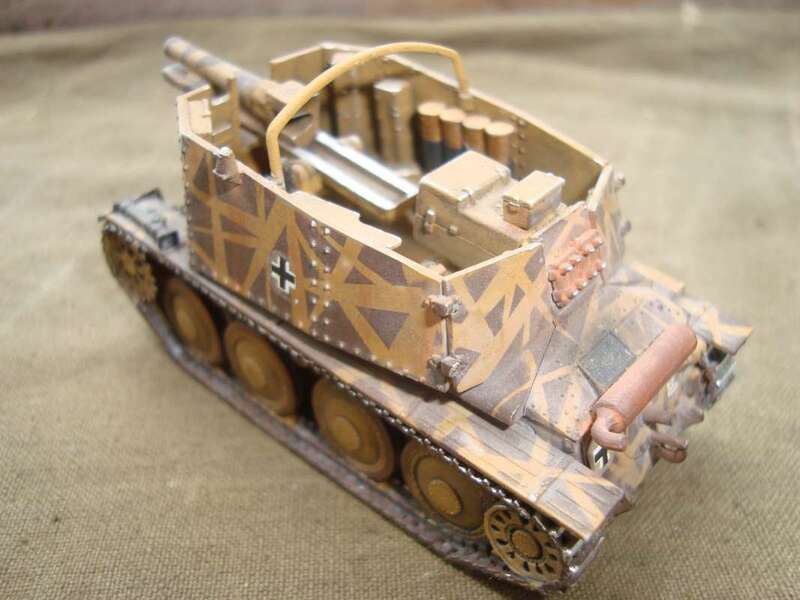 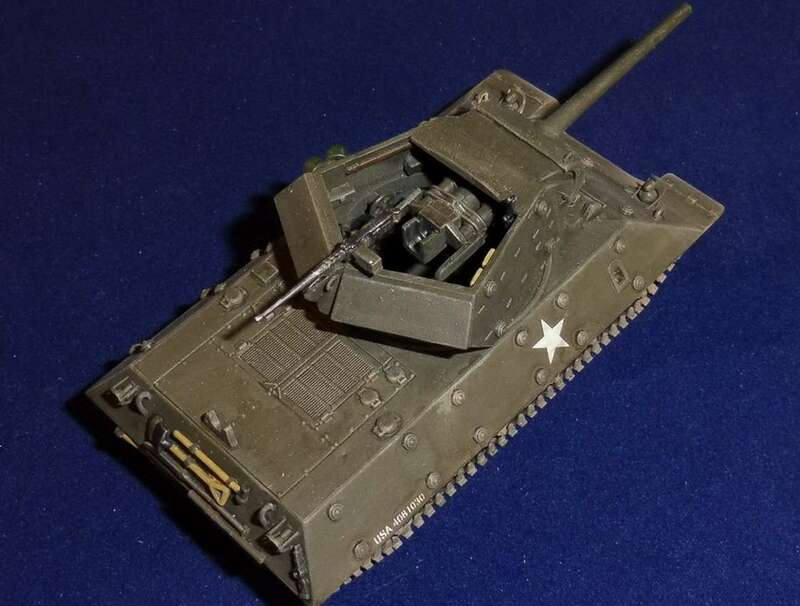 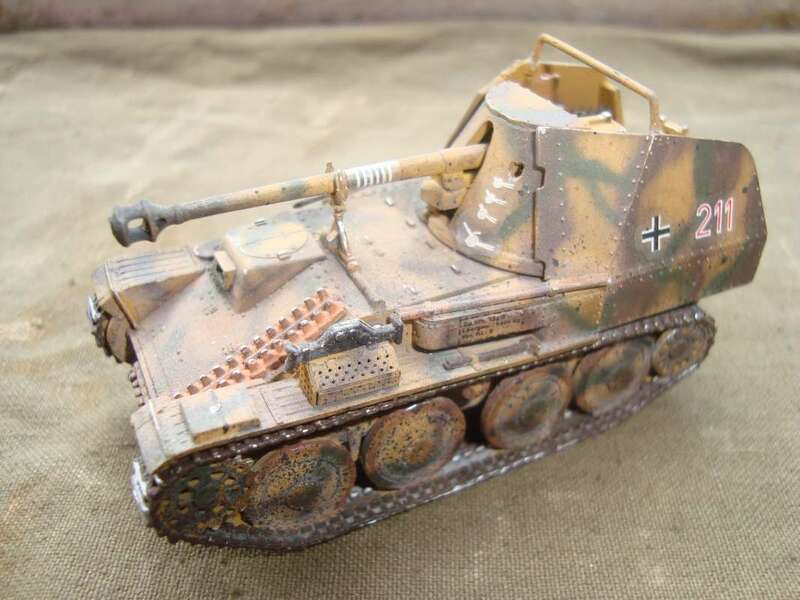 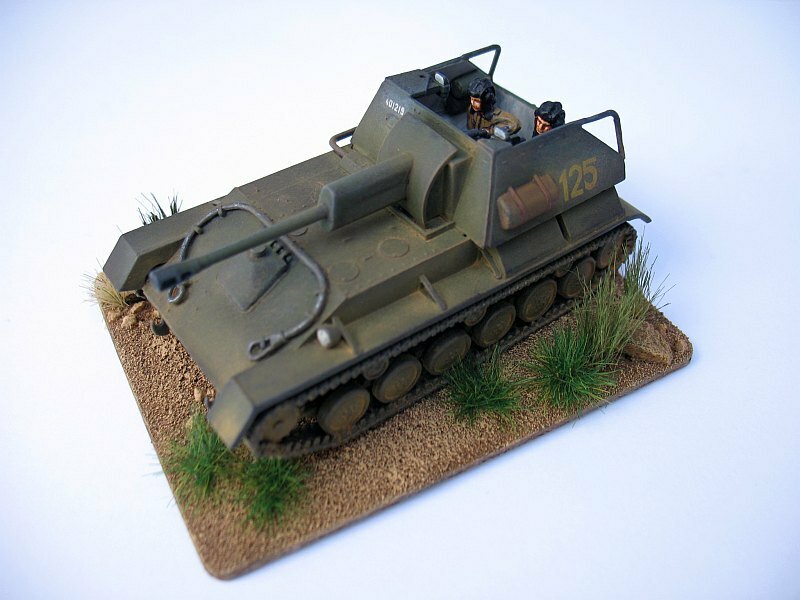 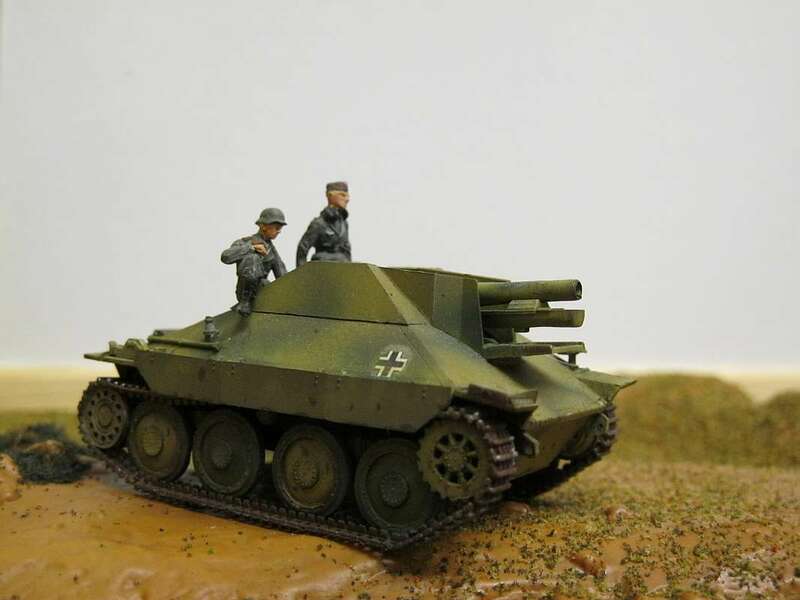 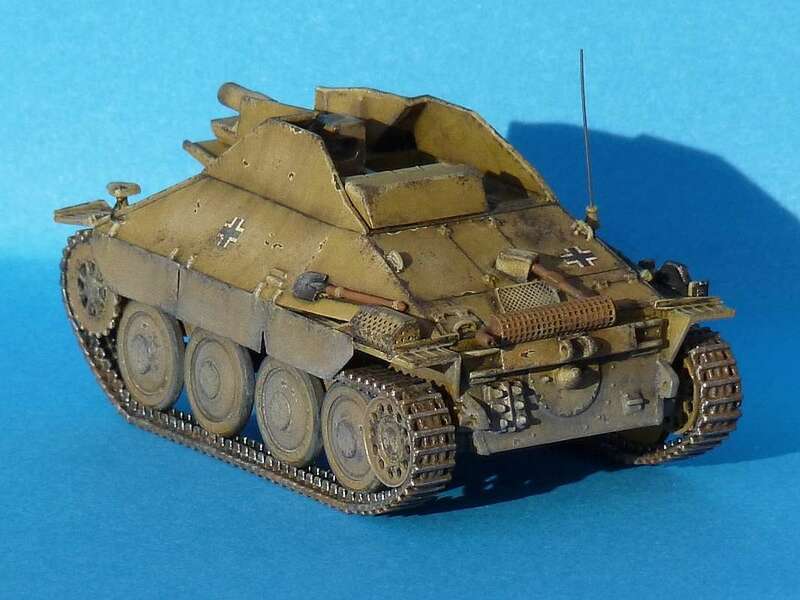 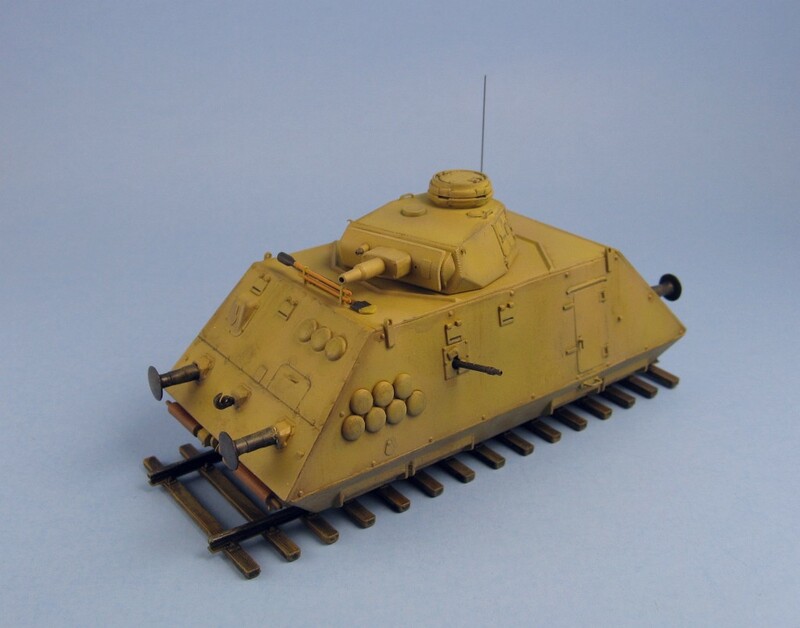 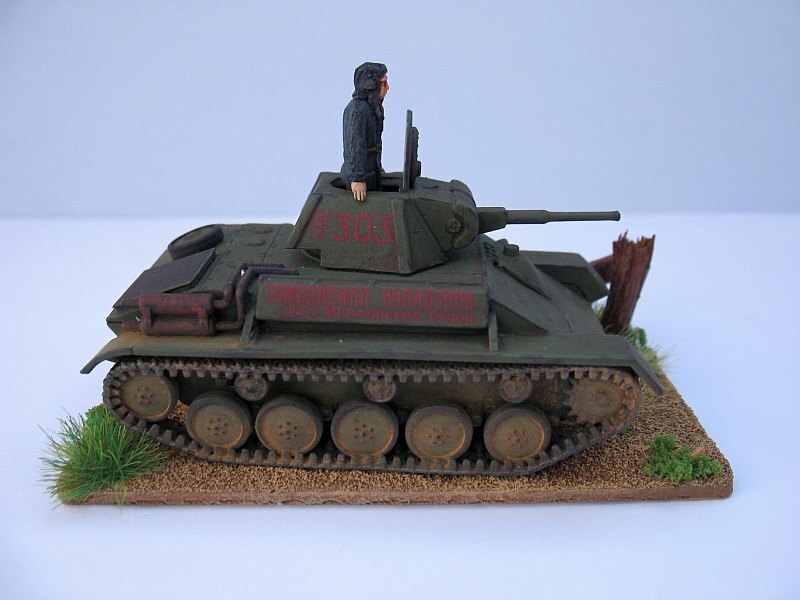 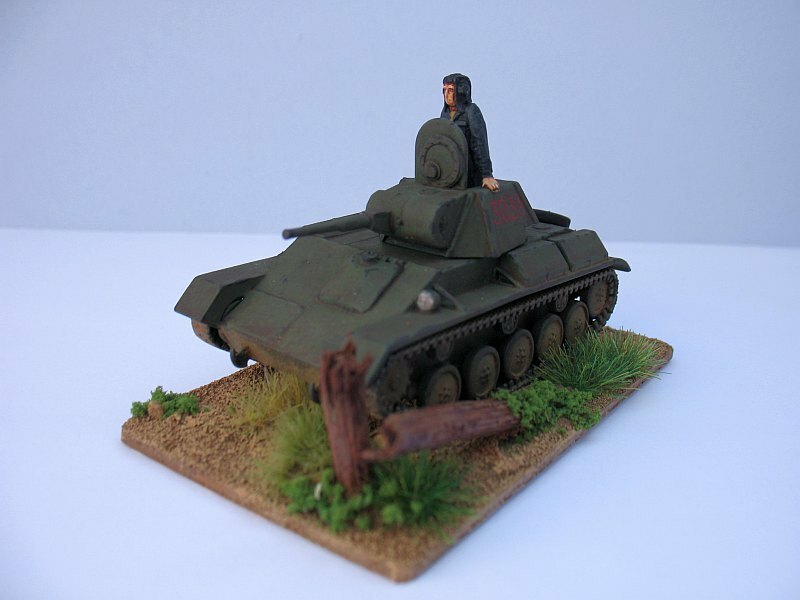 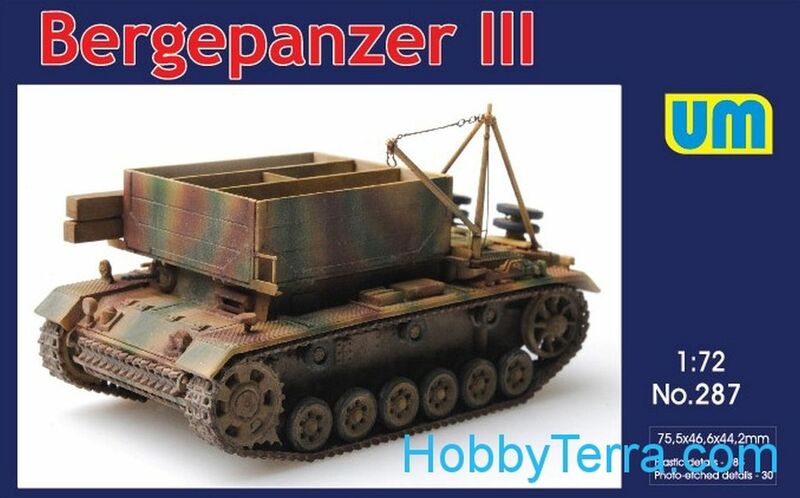 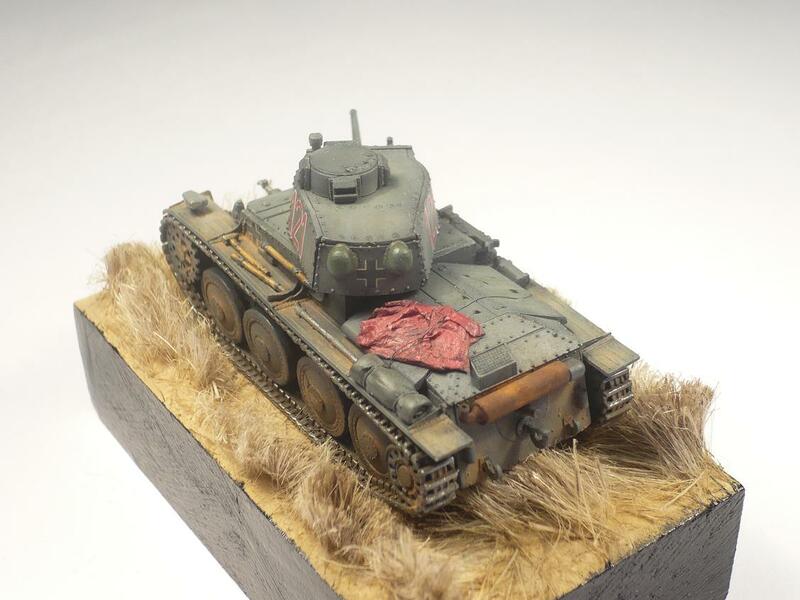 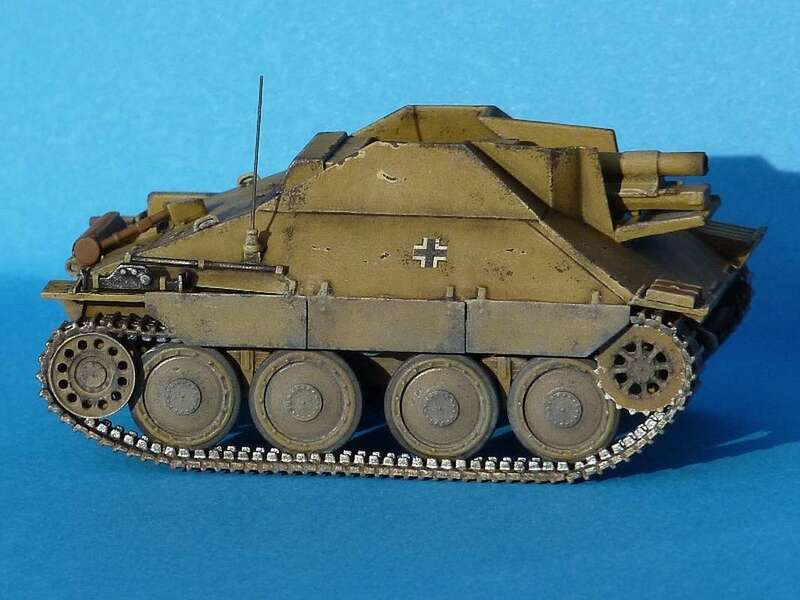 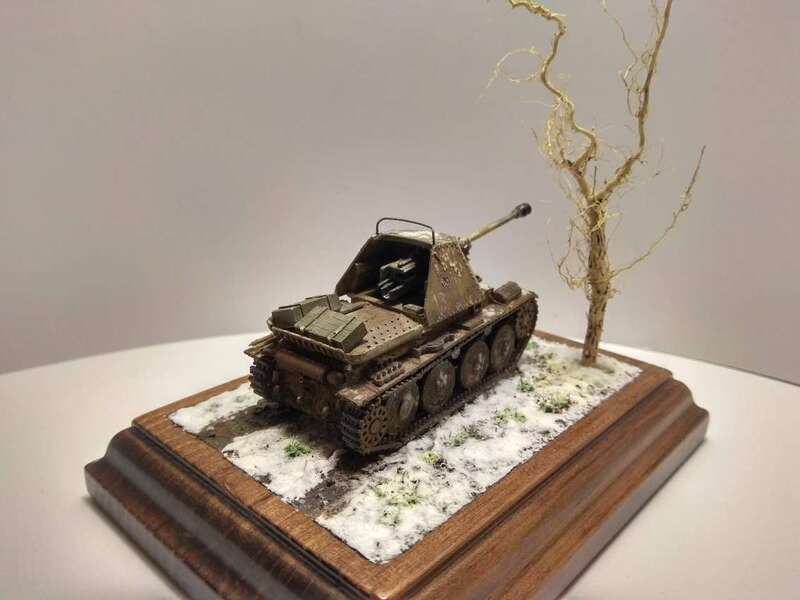 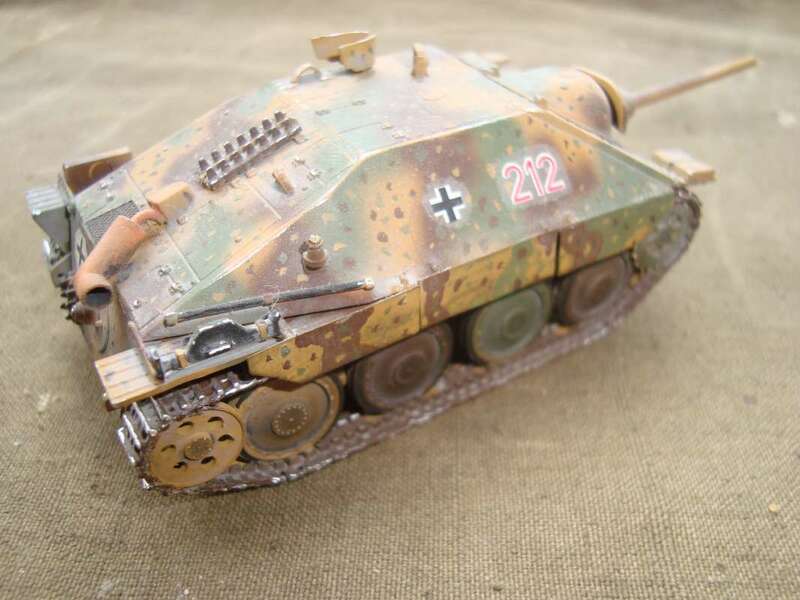 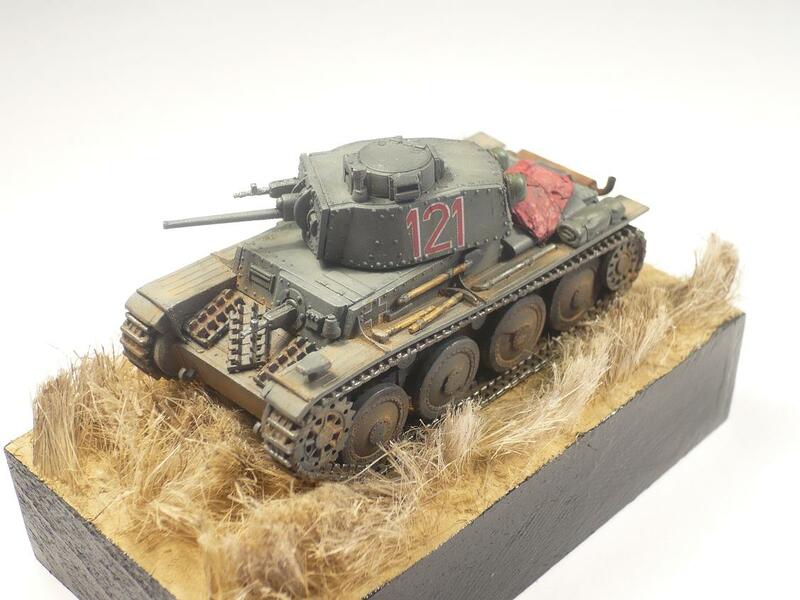 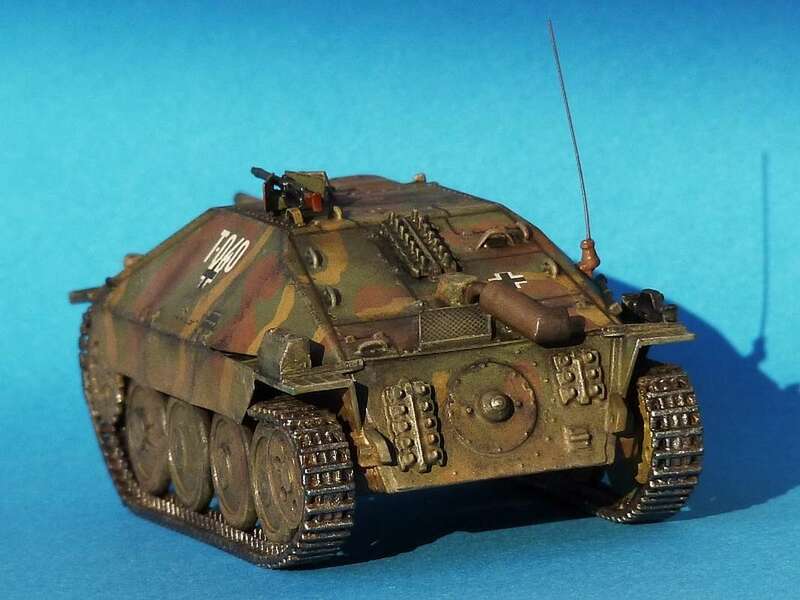 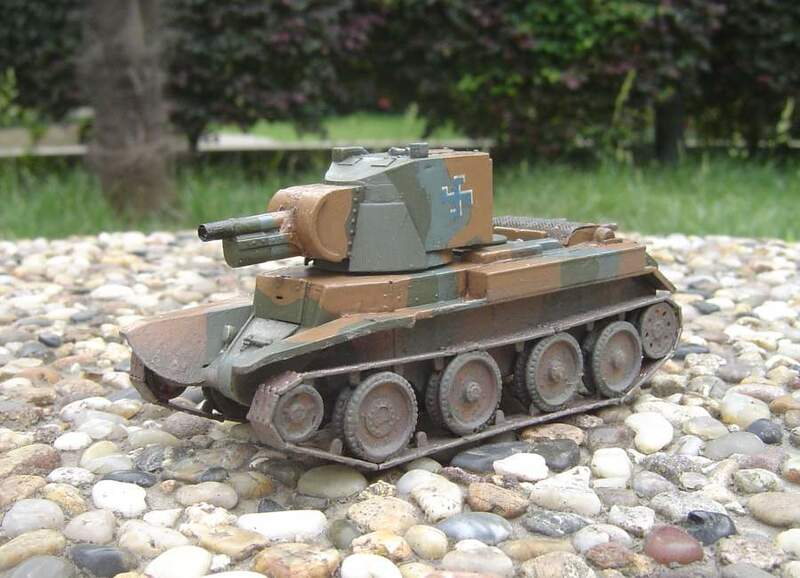 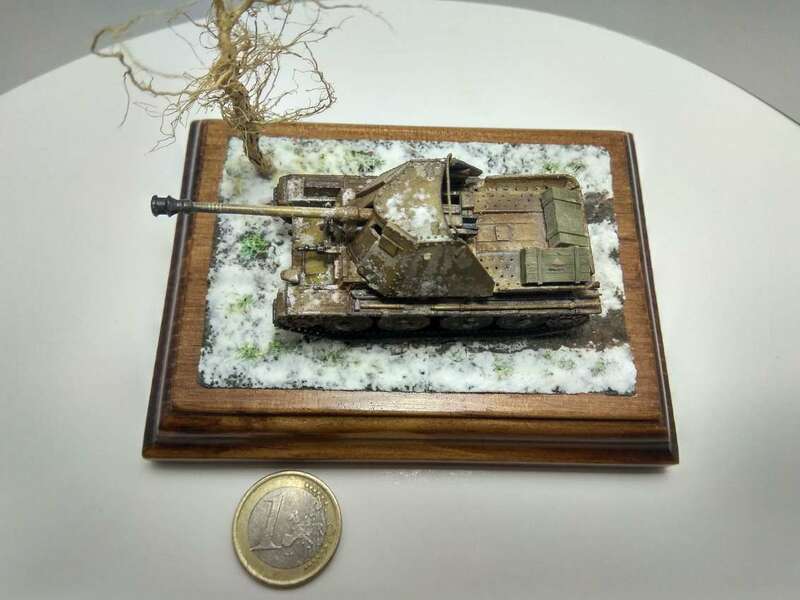 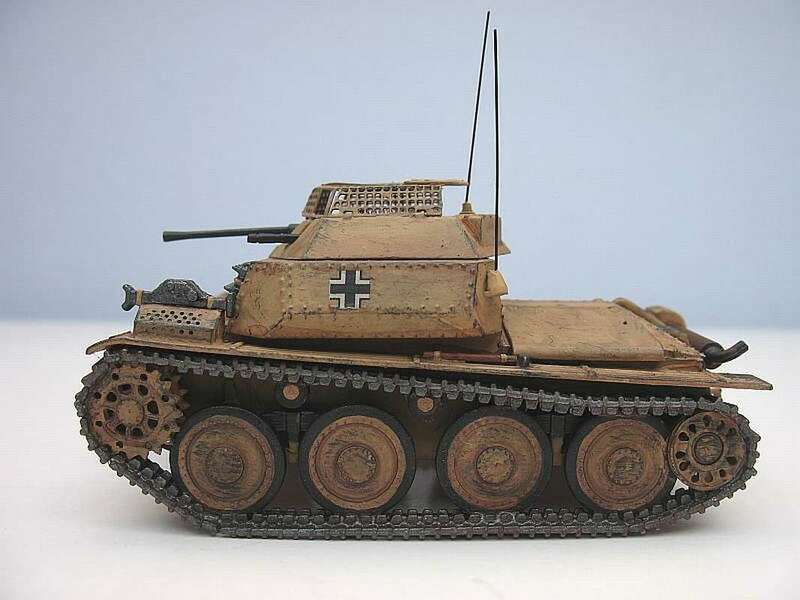 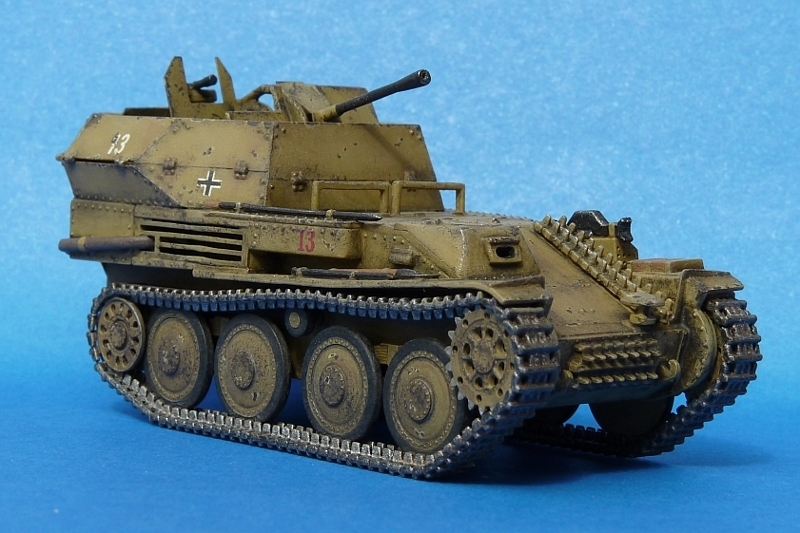 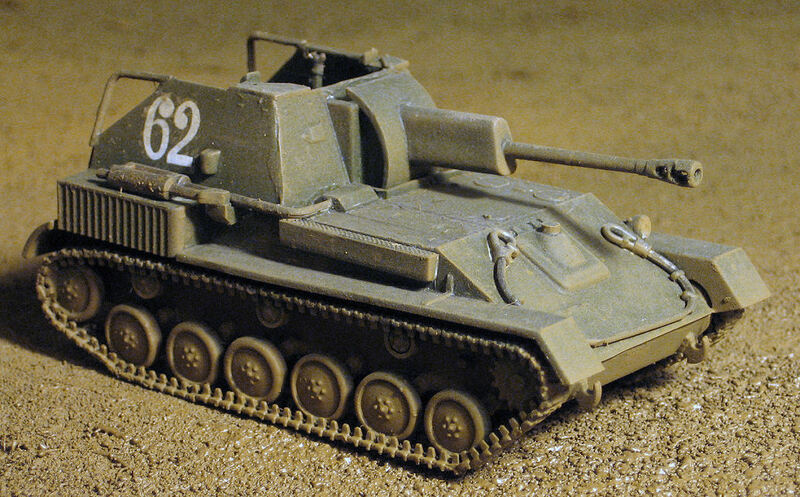 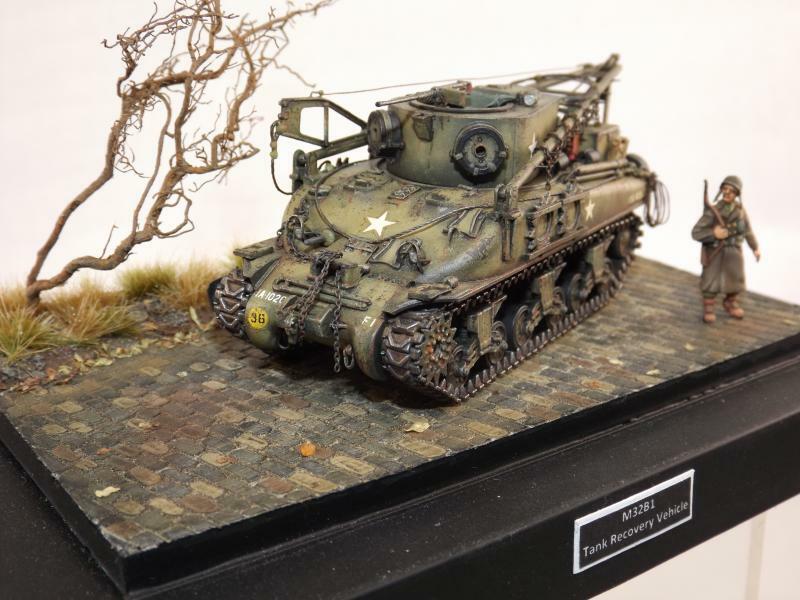 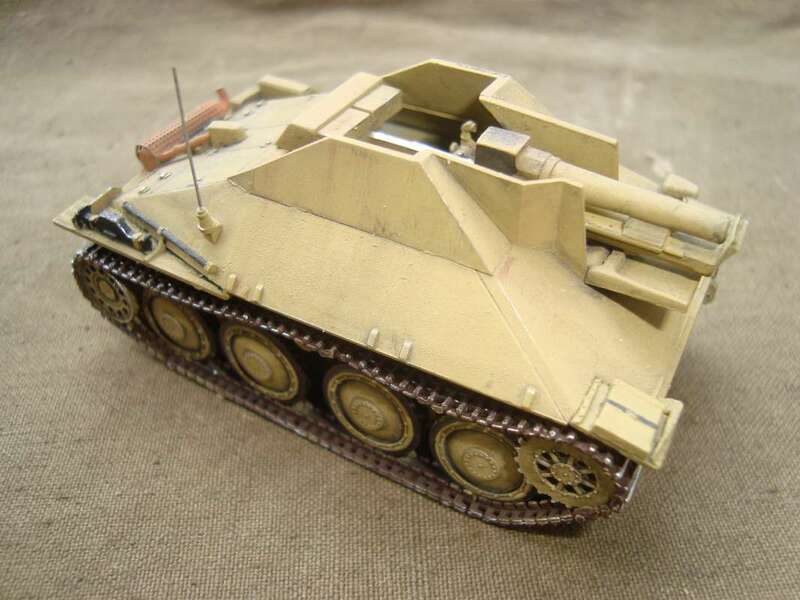 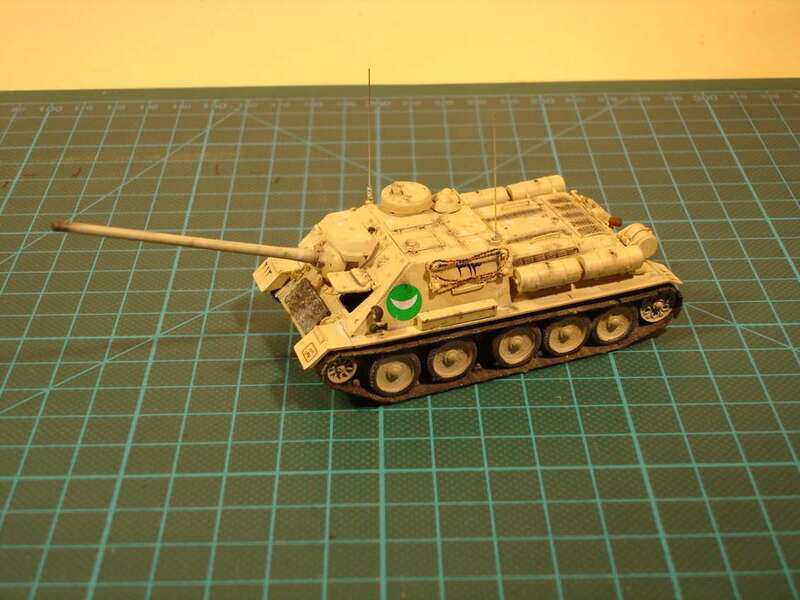 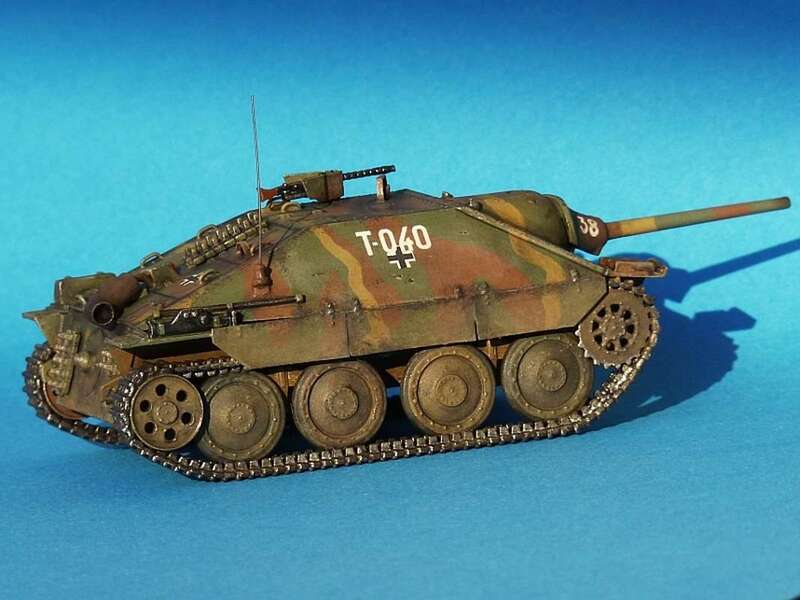 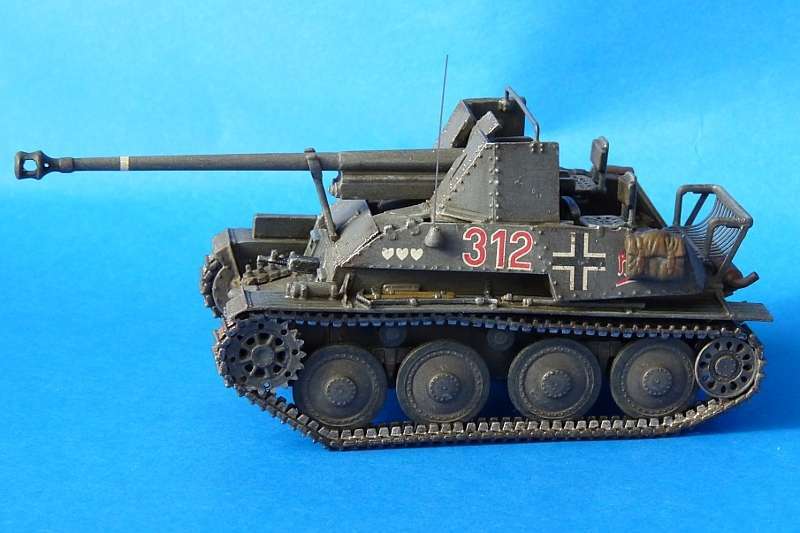 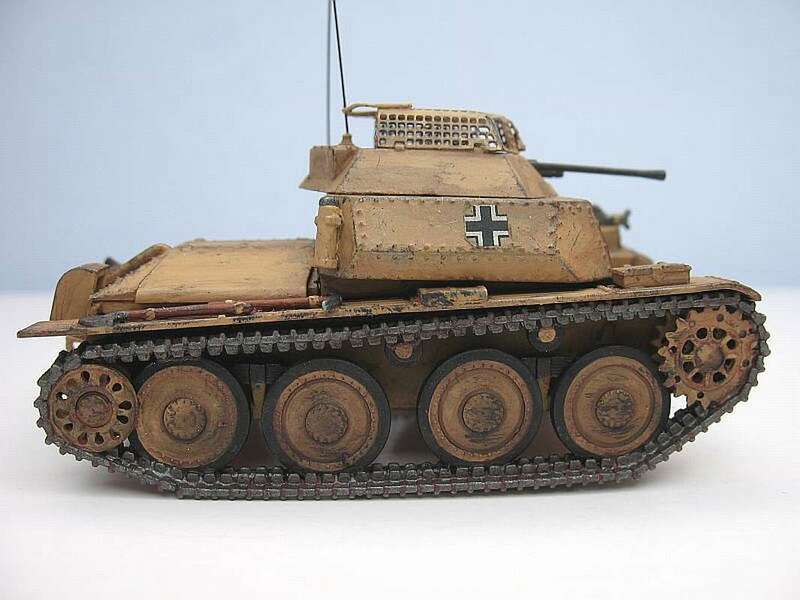 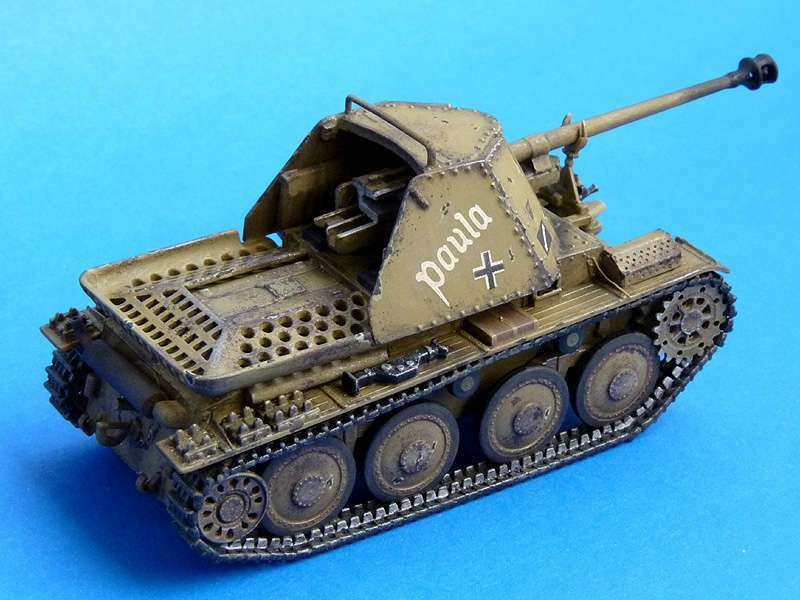 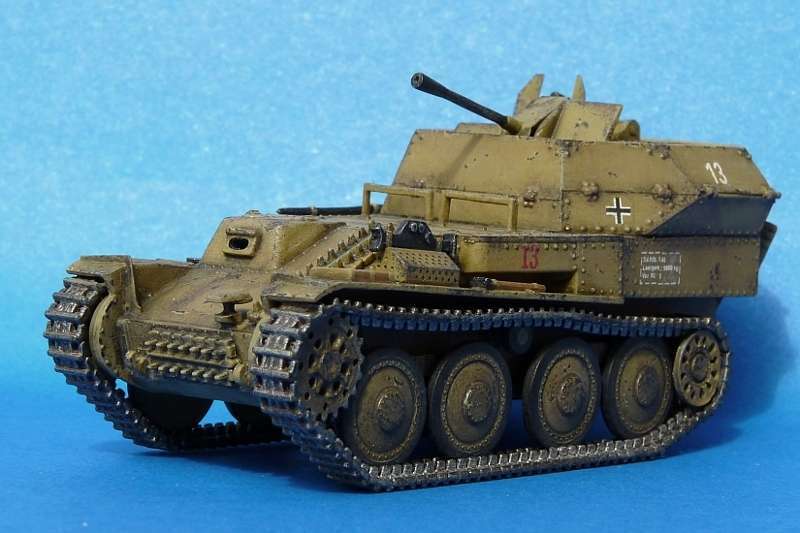 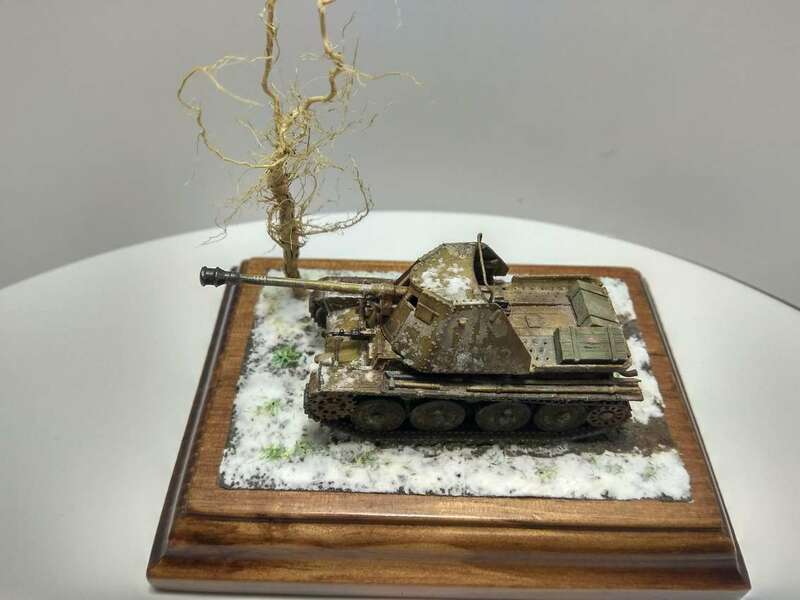 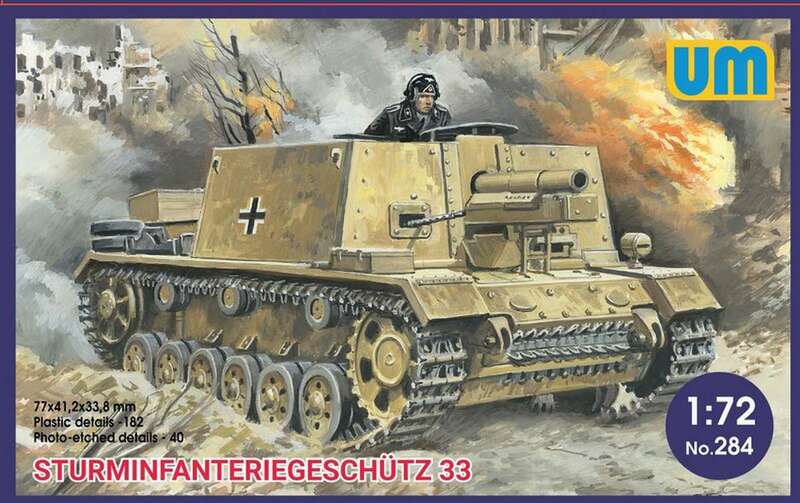 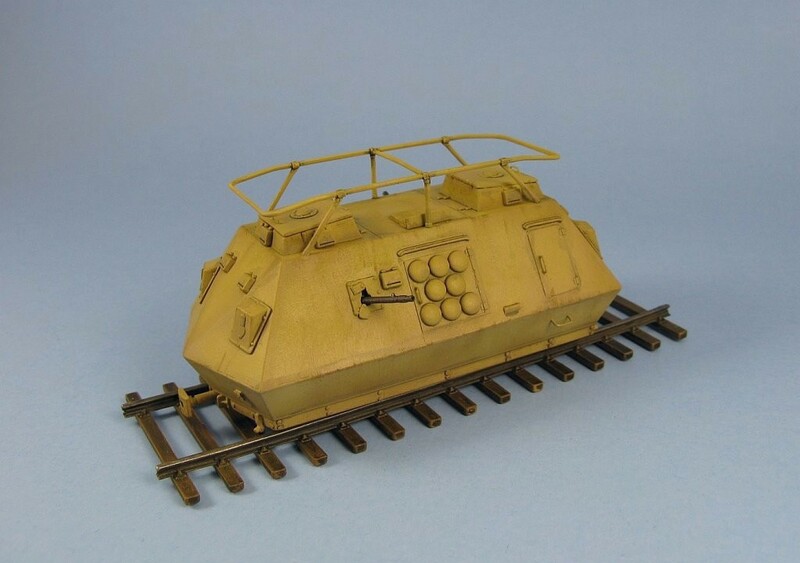 Schienenpanzer Kommandowagen that I had built early in the new year. 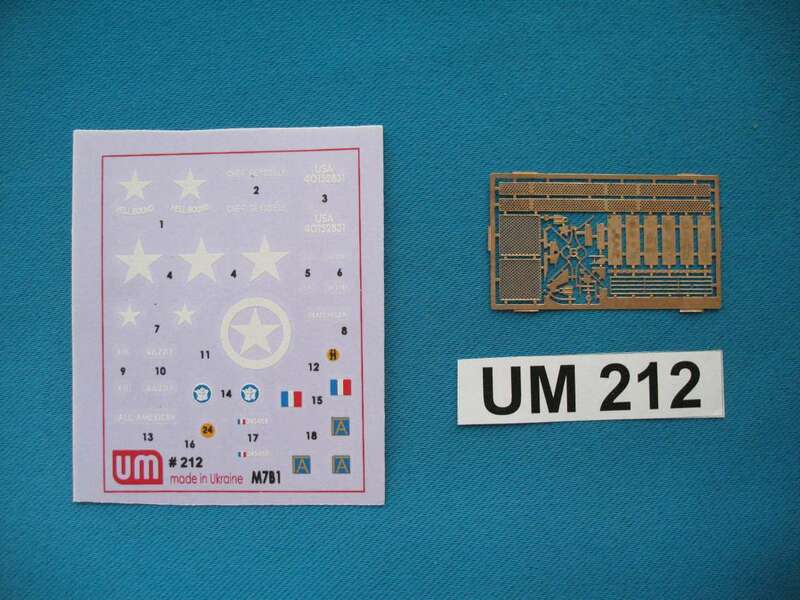 What I got from UM, as far as I'm concerned, is a huge disappointment. 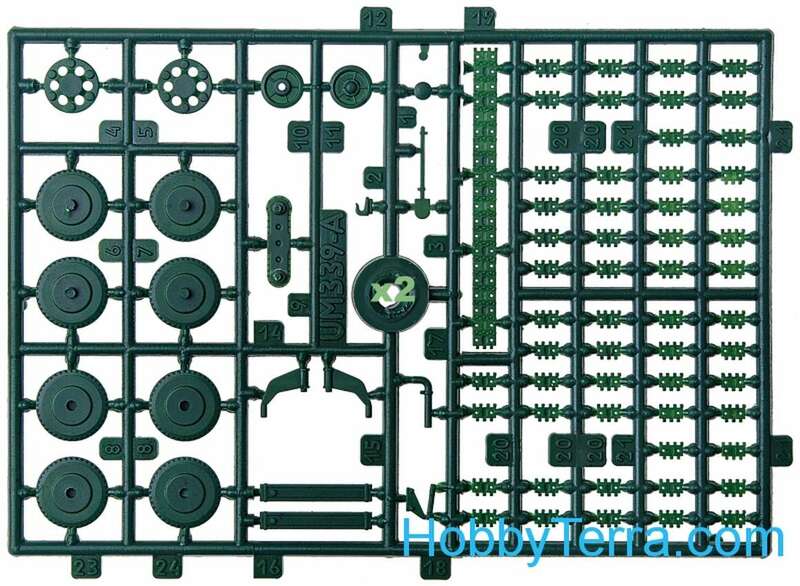 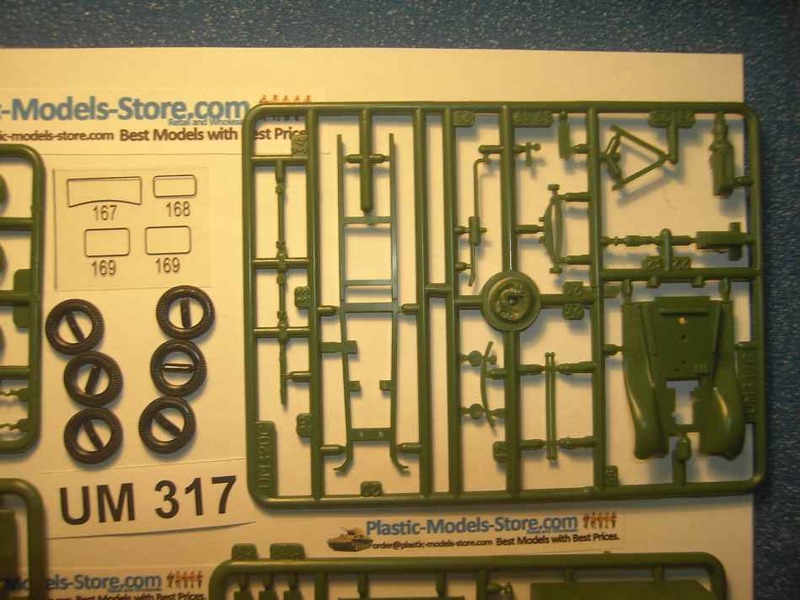 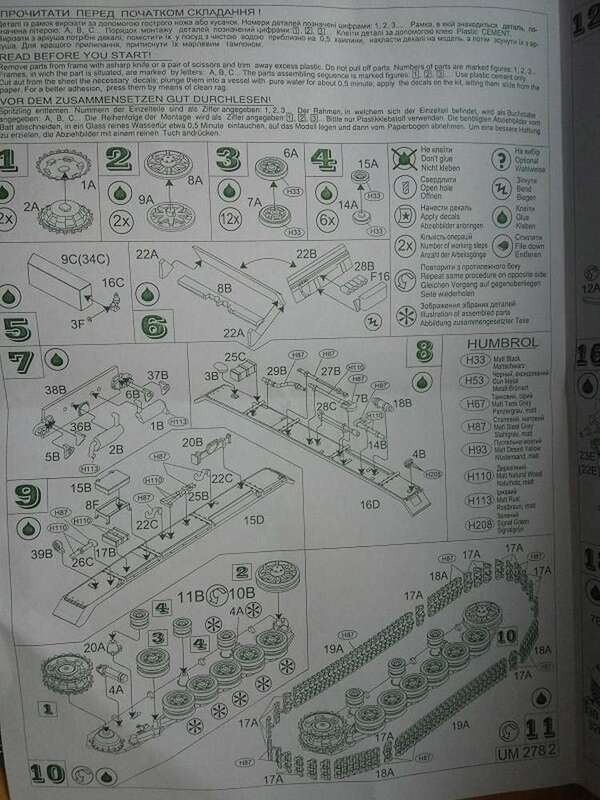 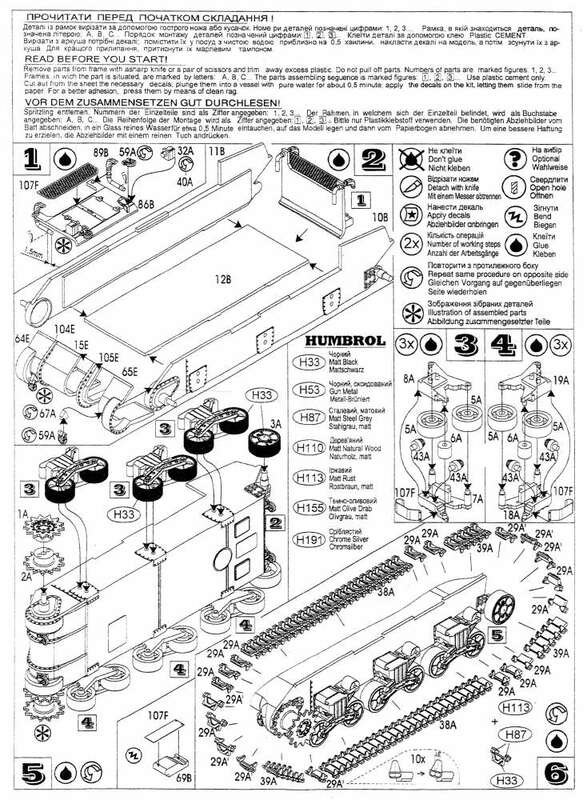 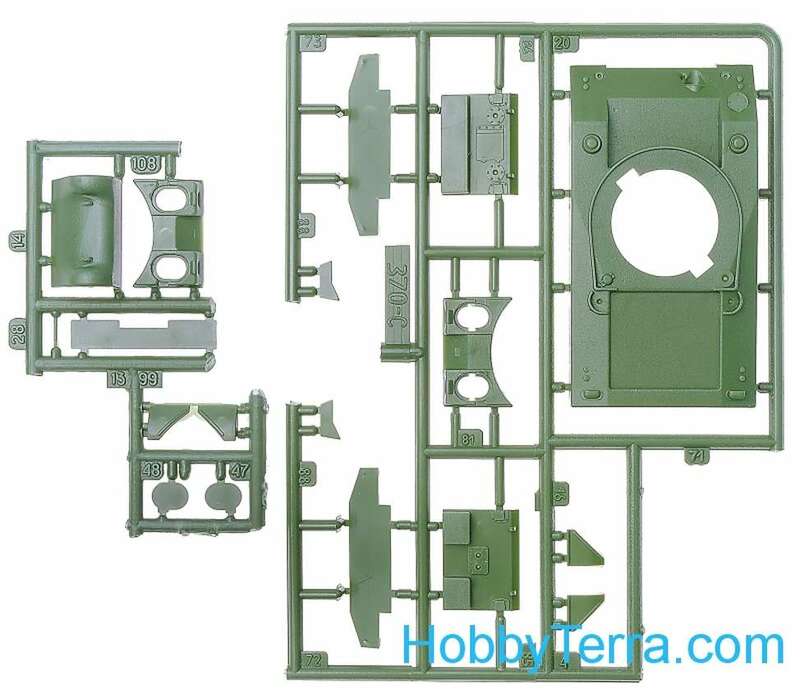 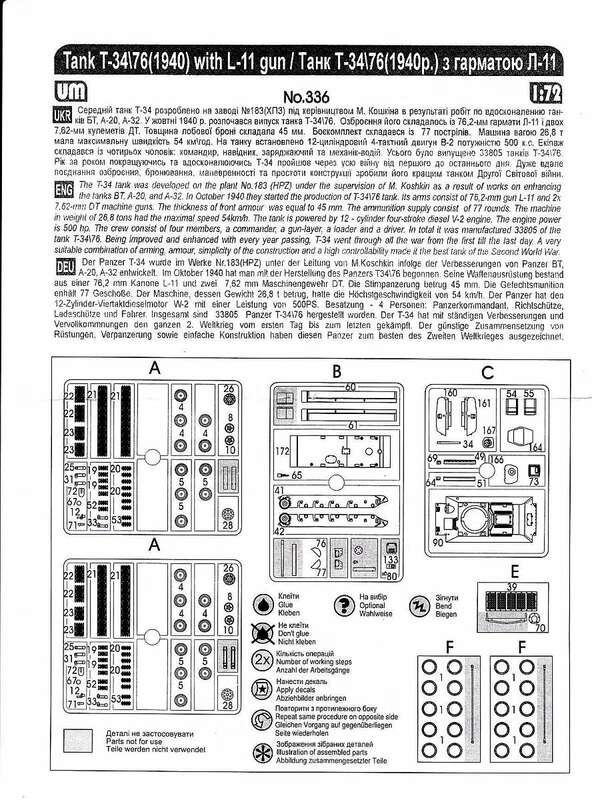 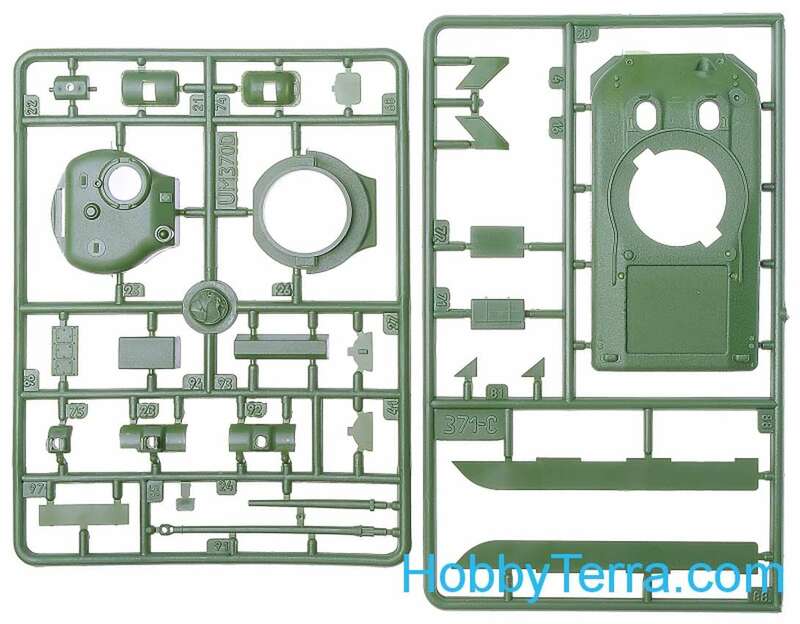 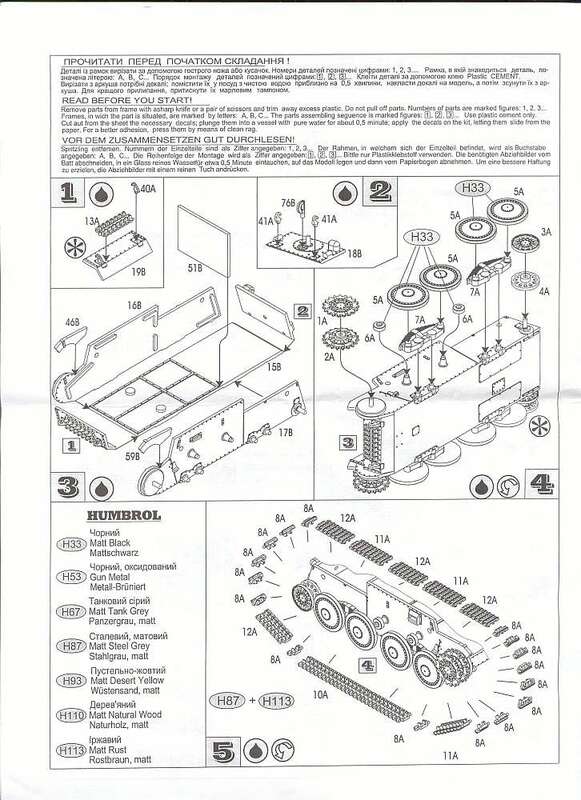 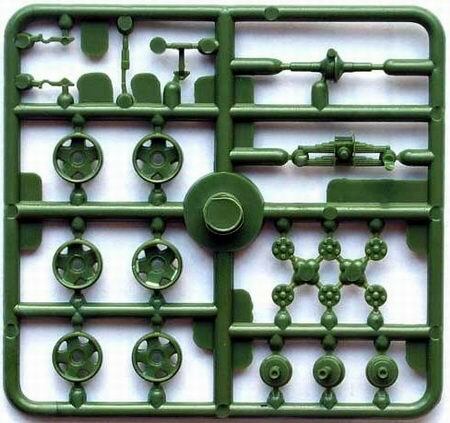 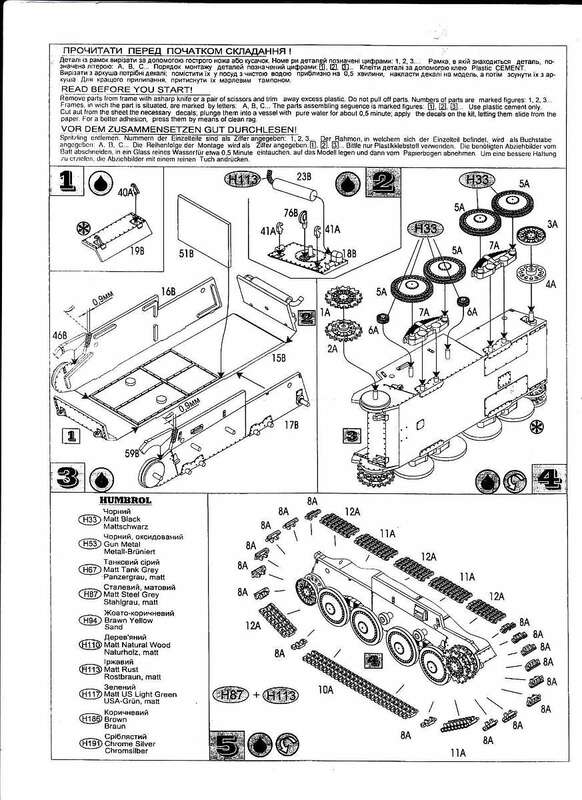 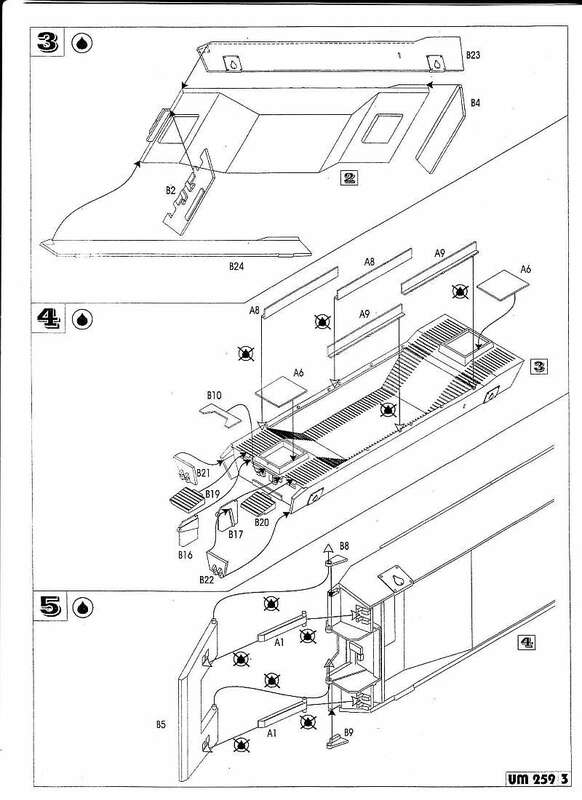 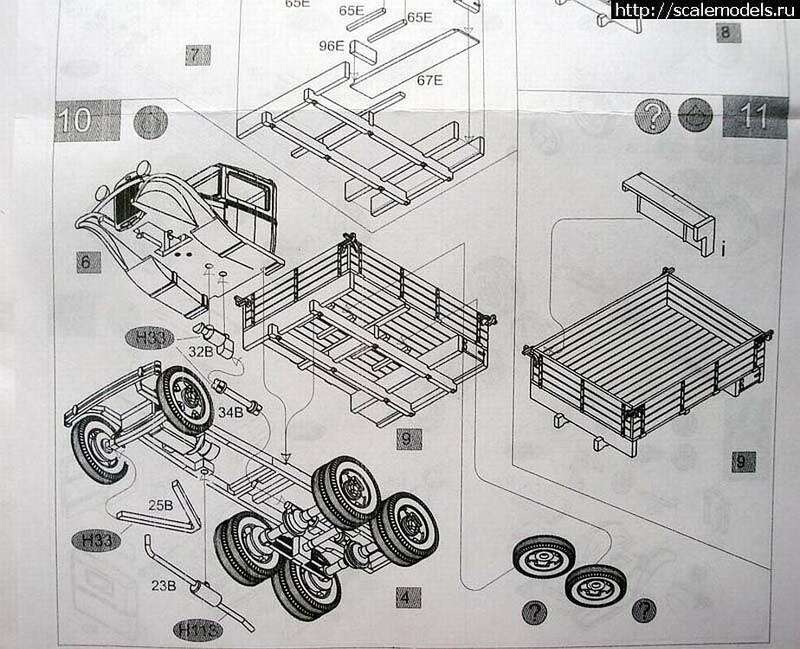 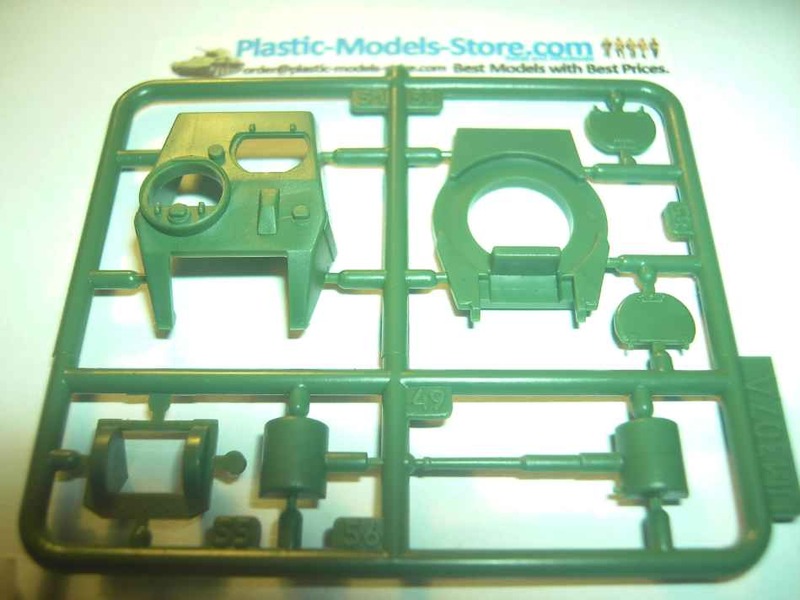 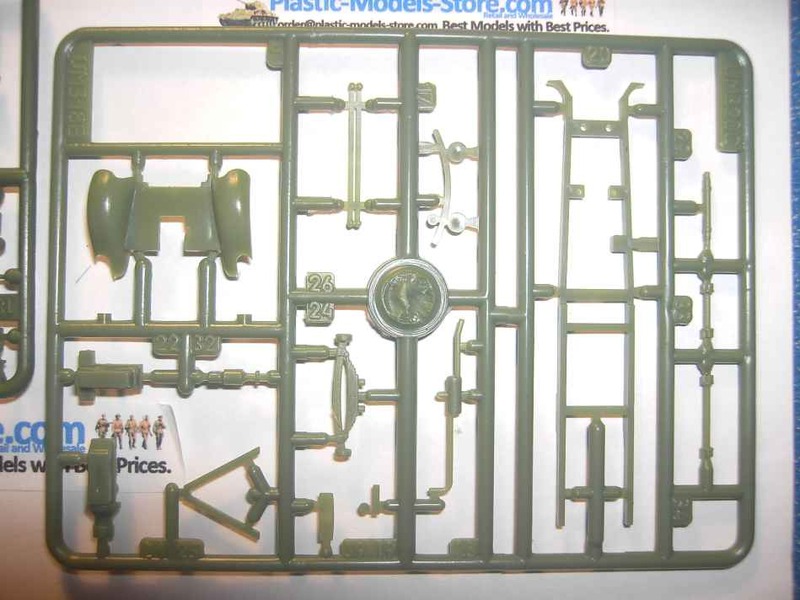 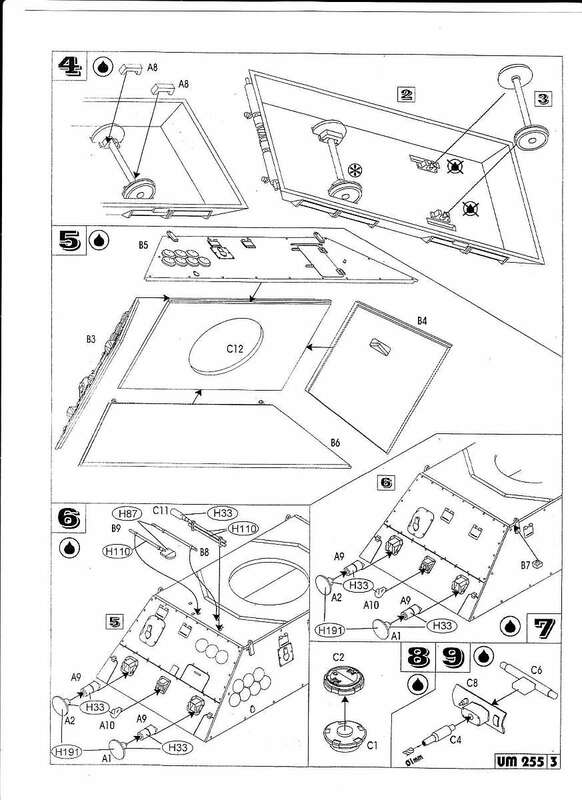 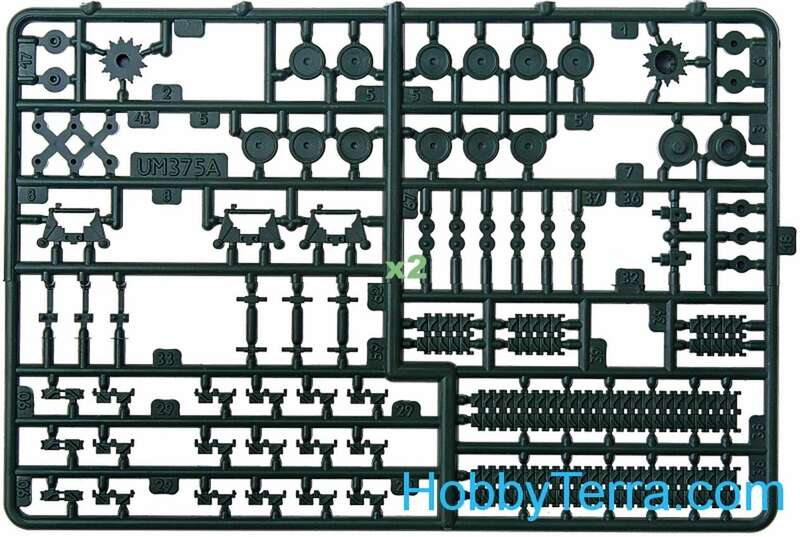 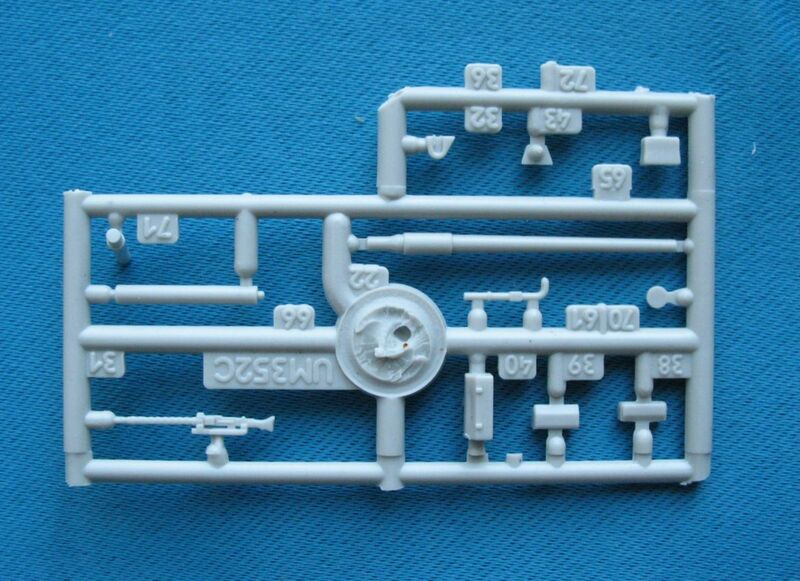 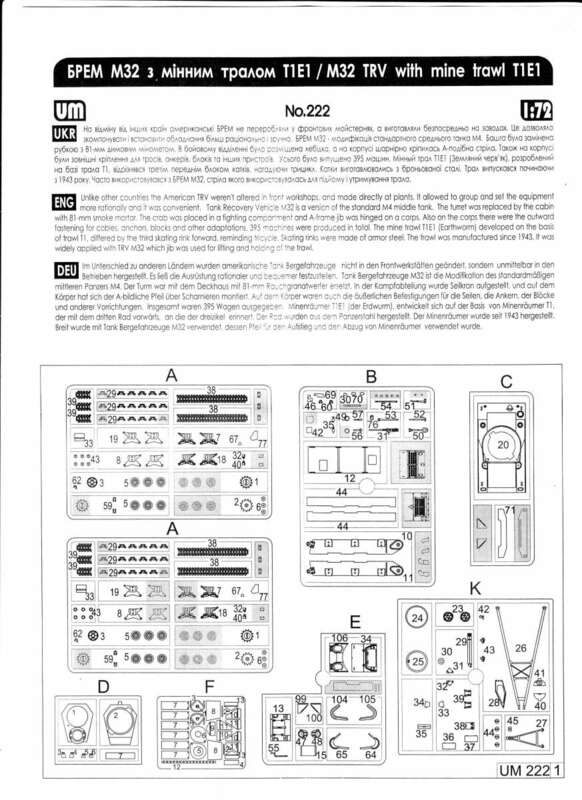 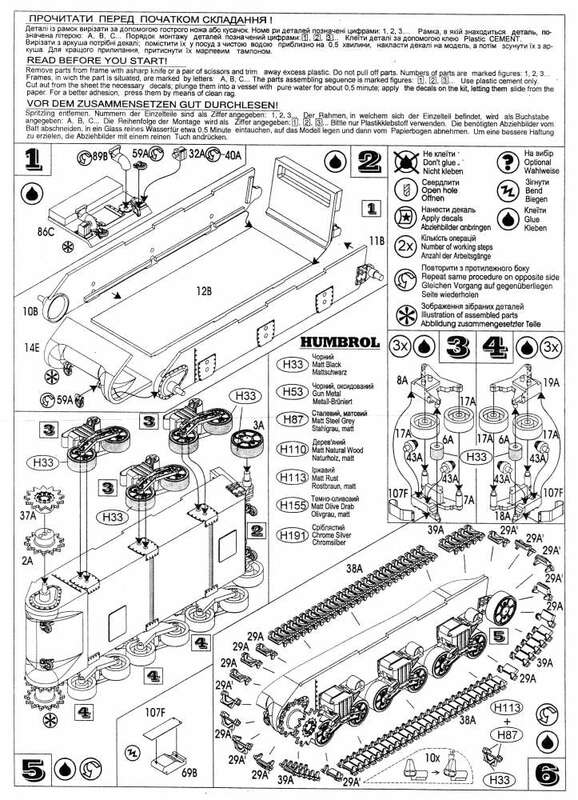 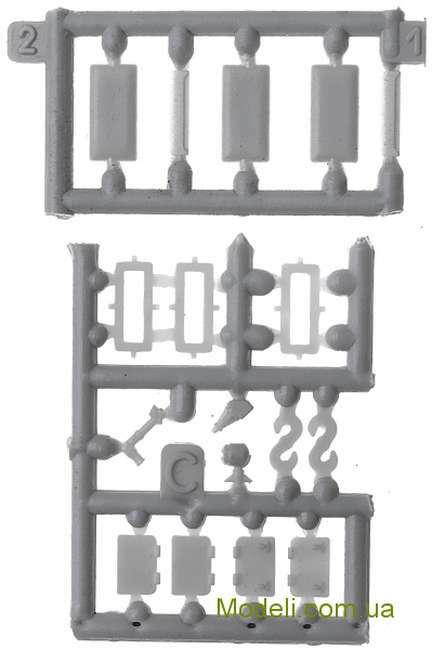 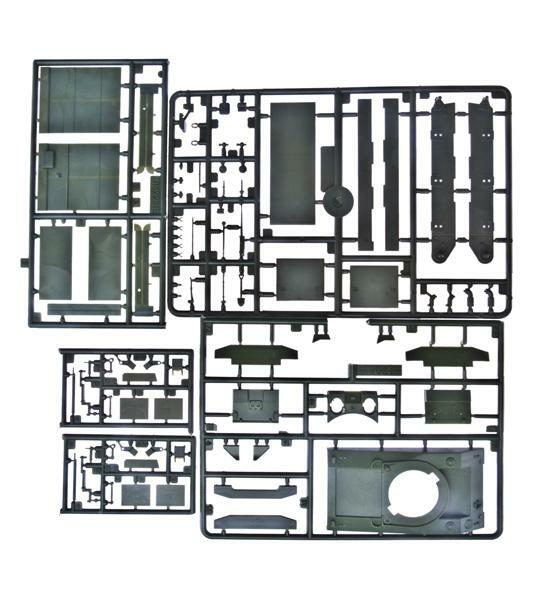 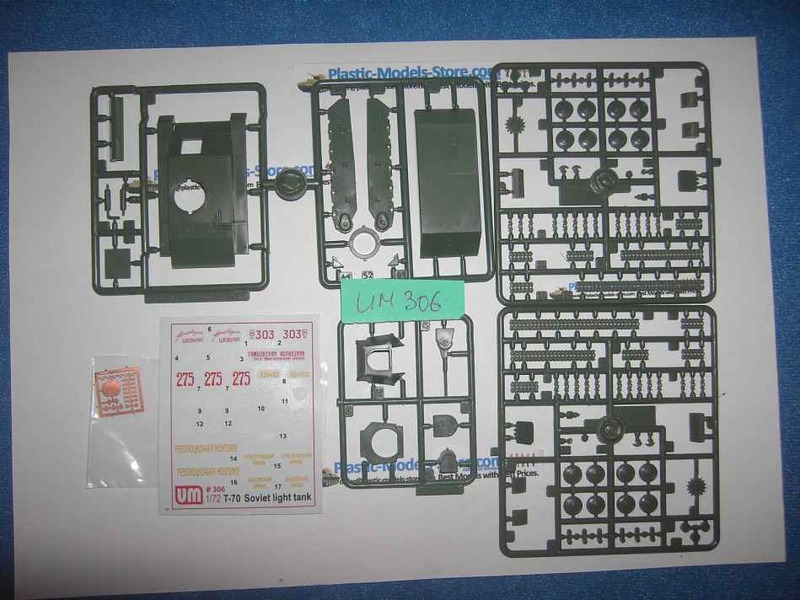 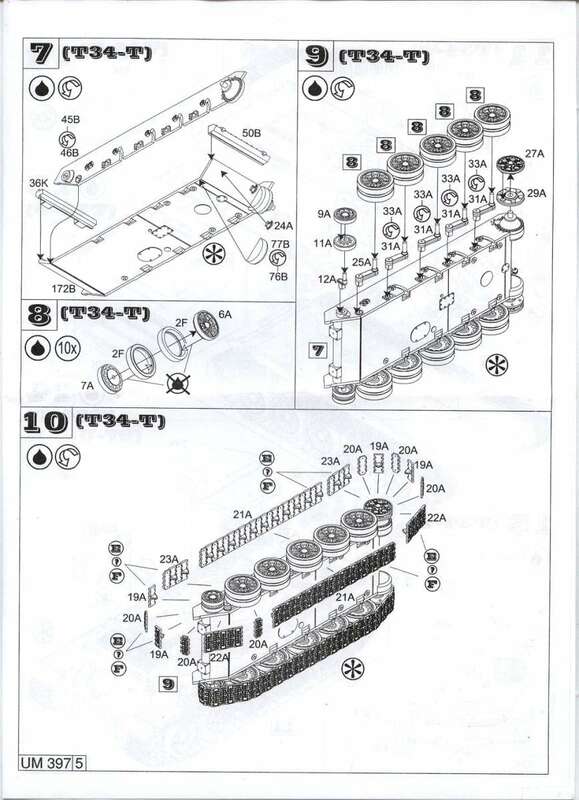 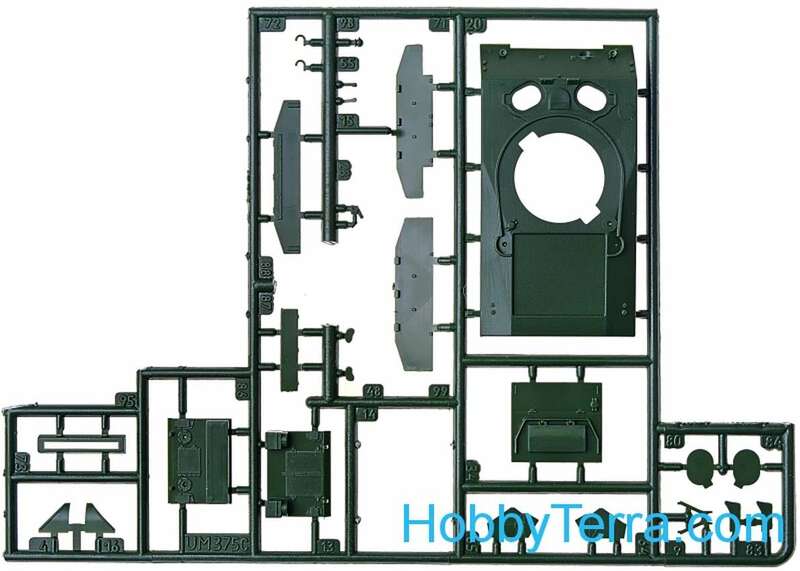 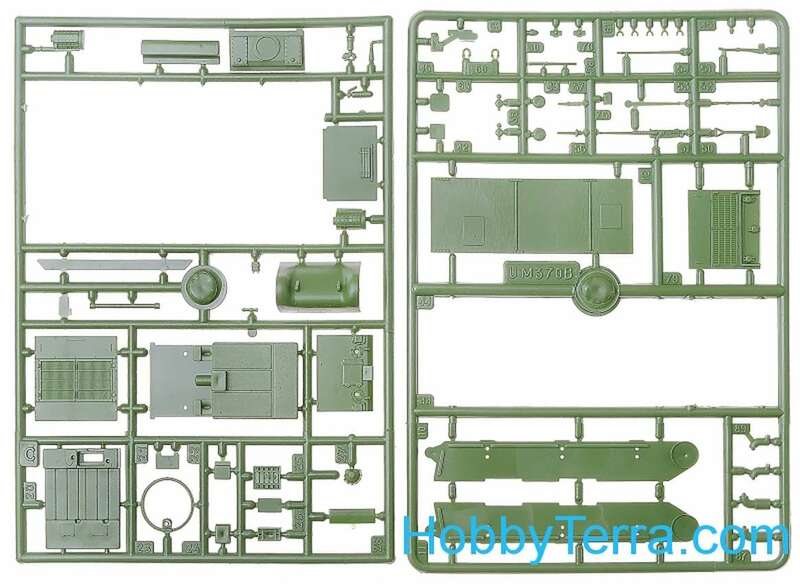 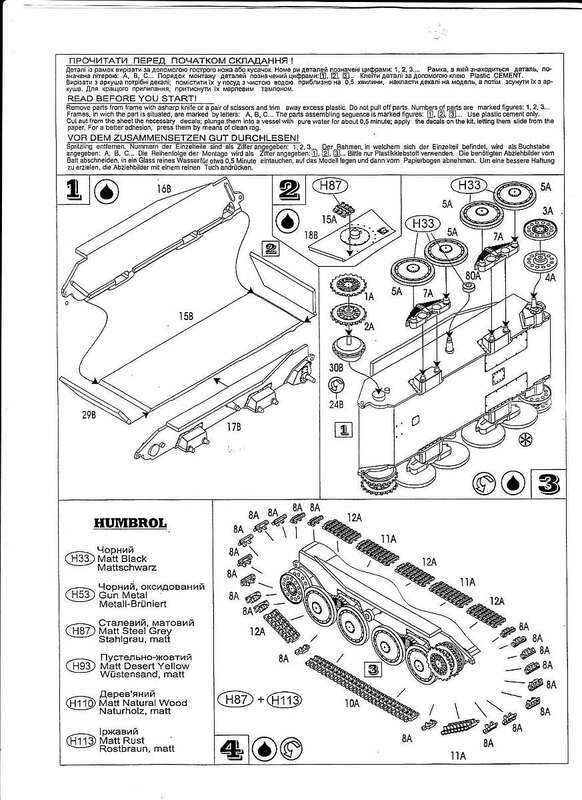 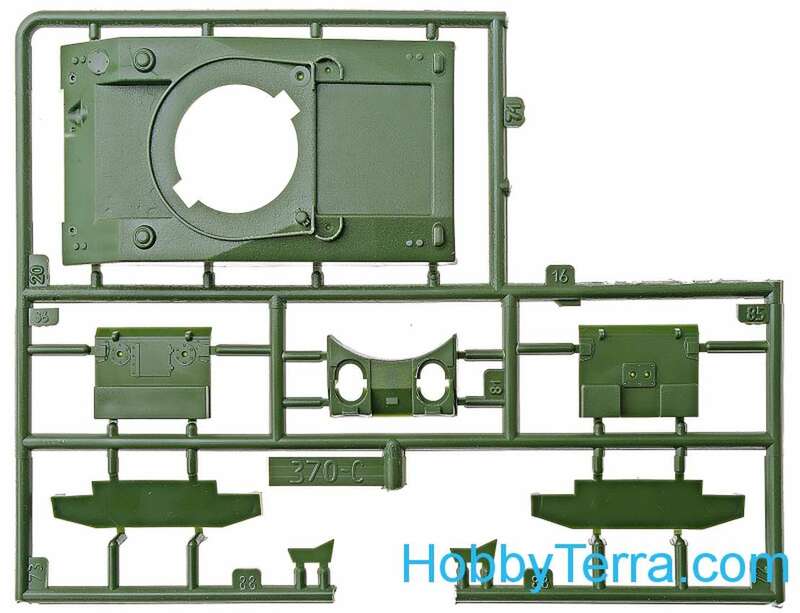 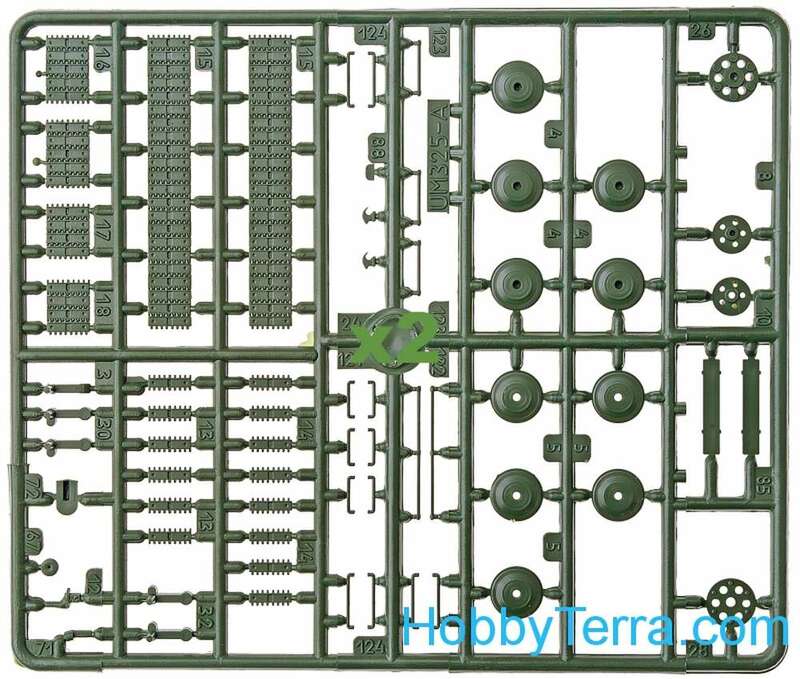 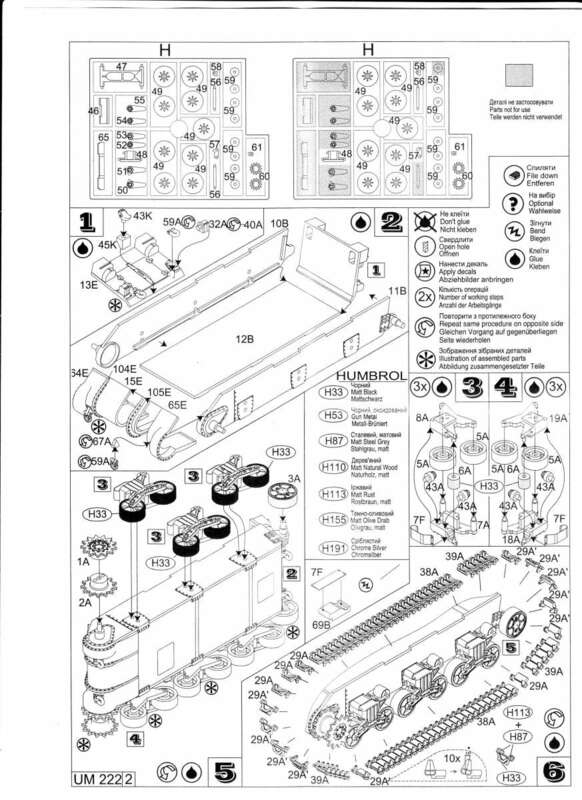 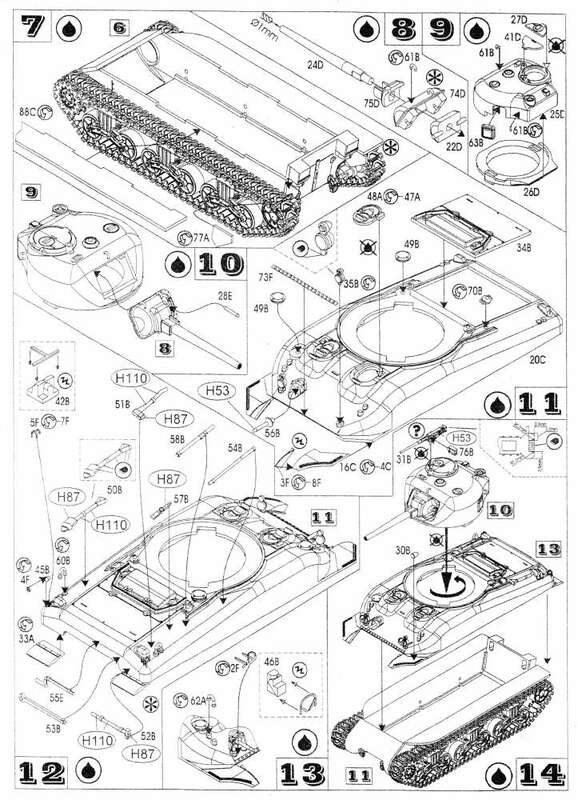 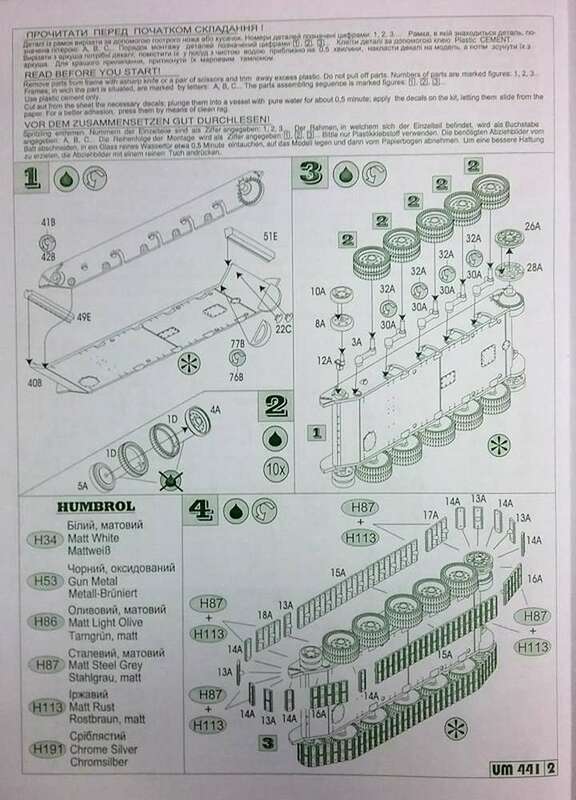 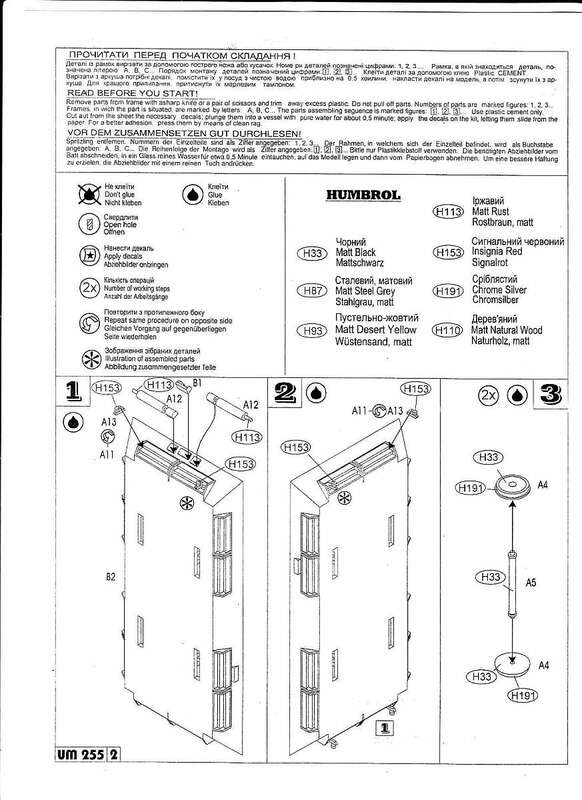 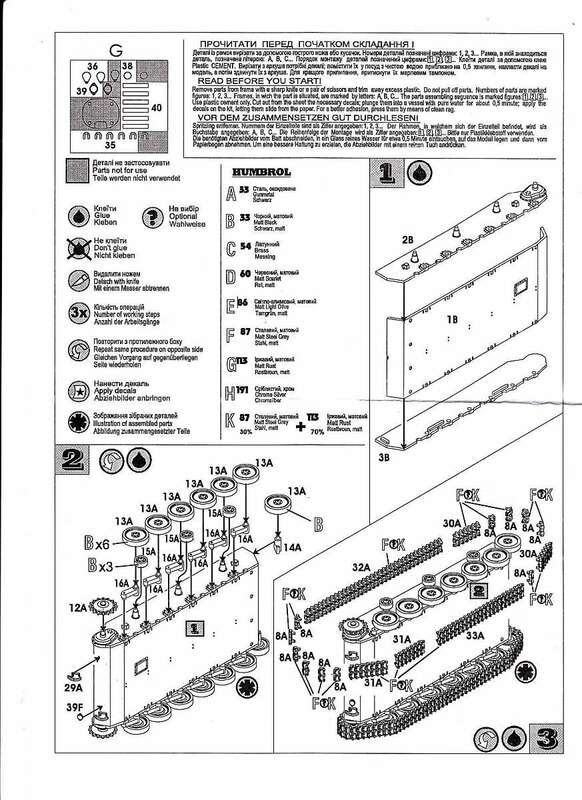 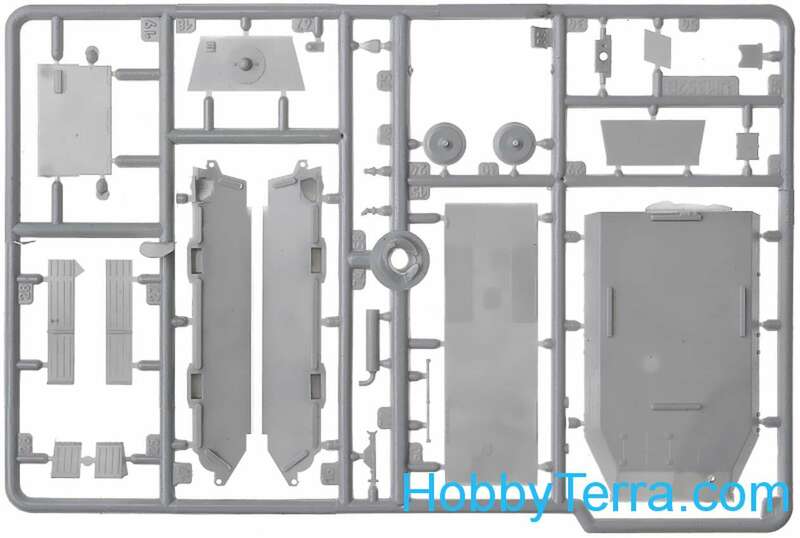 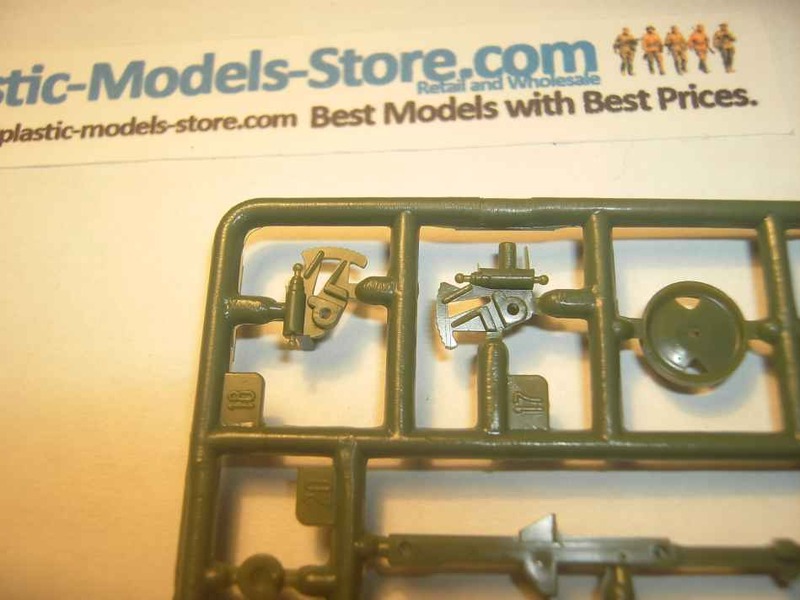 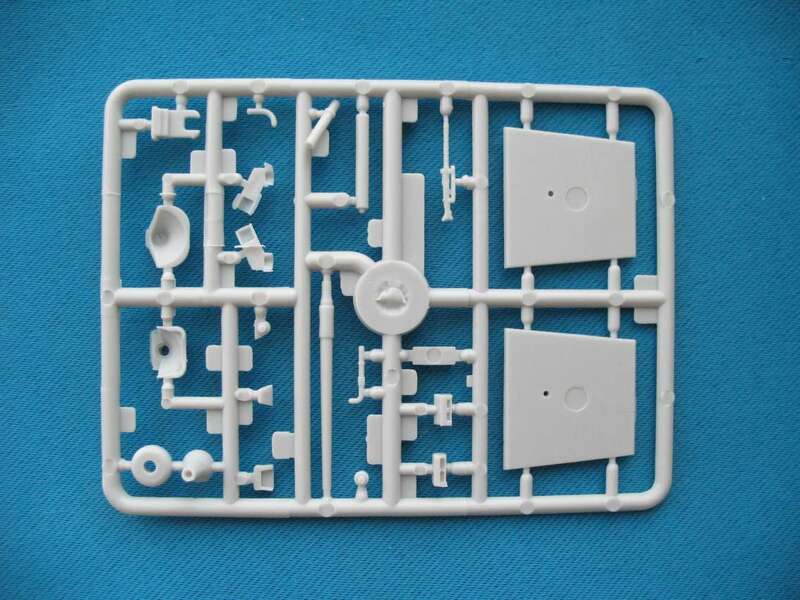 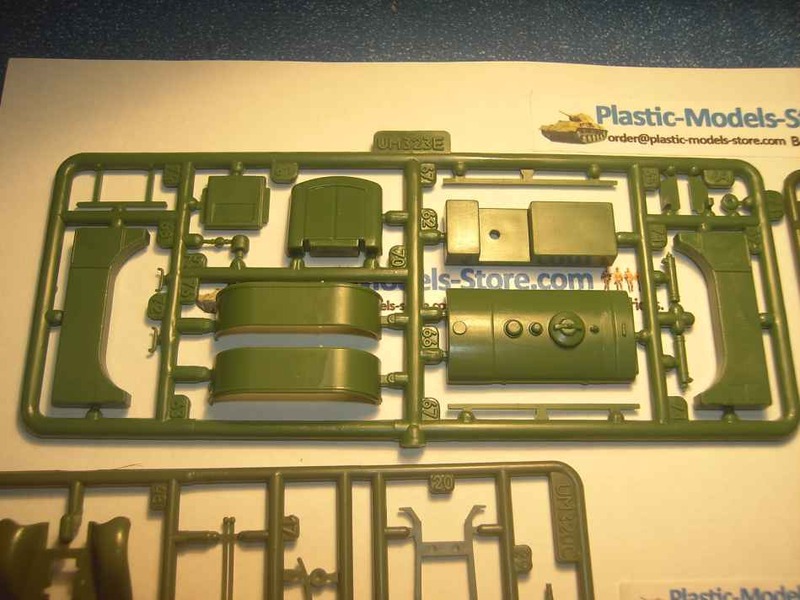 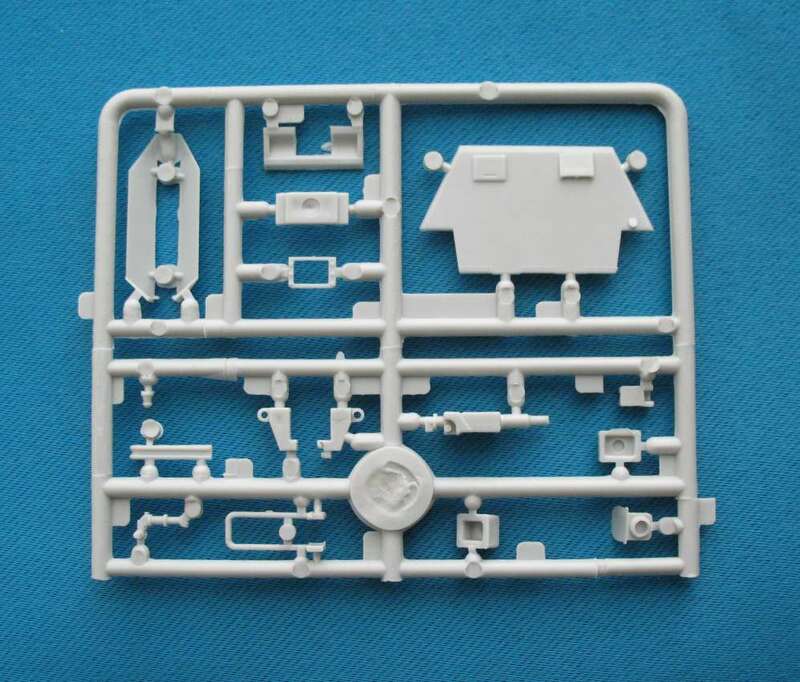 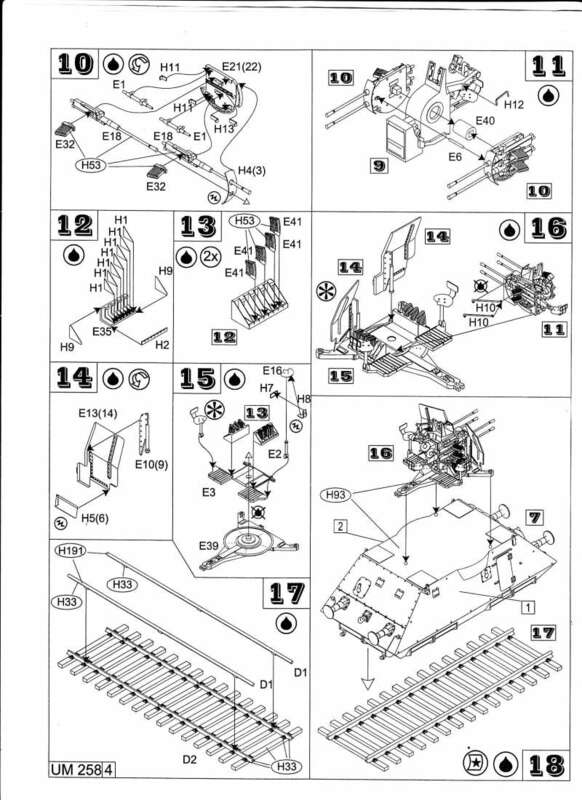 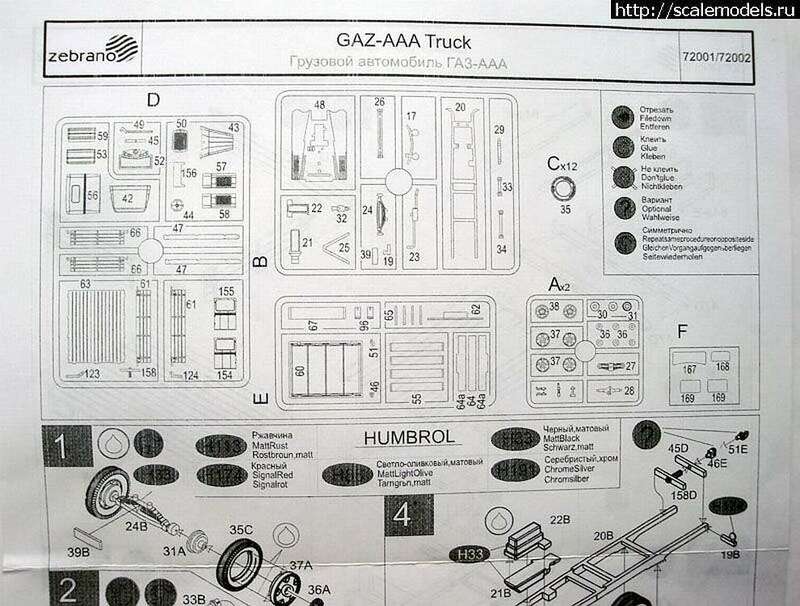 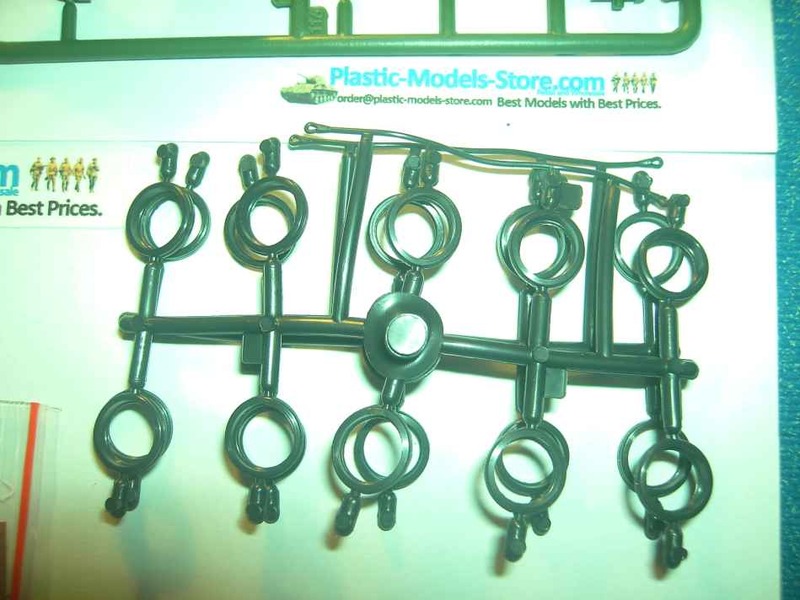 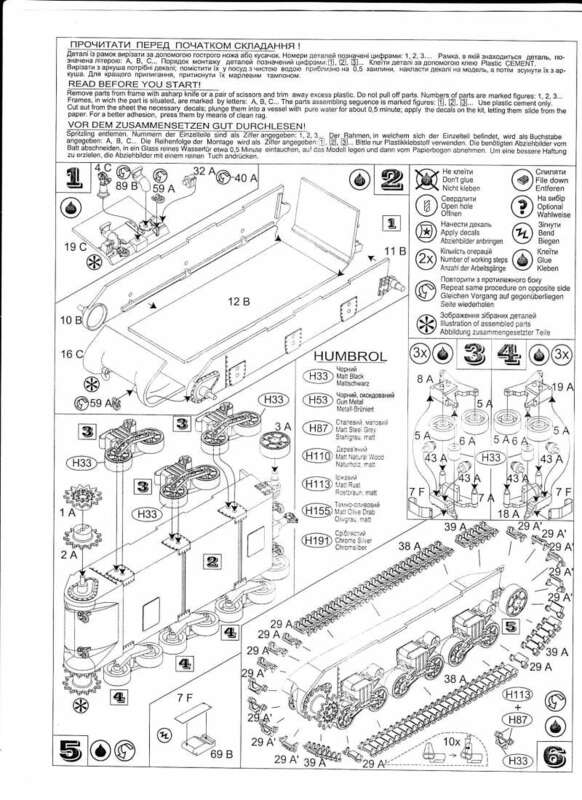 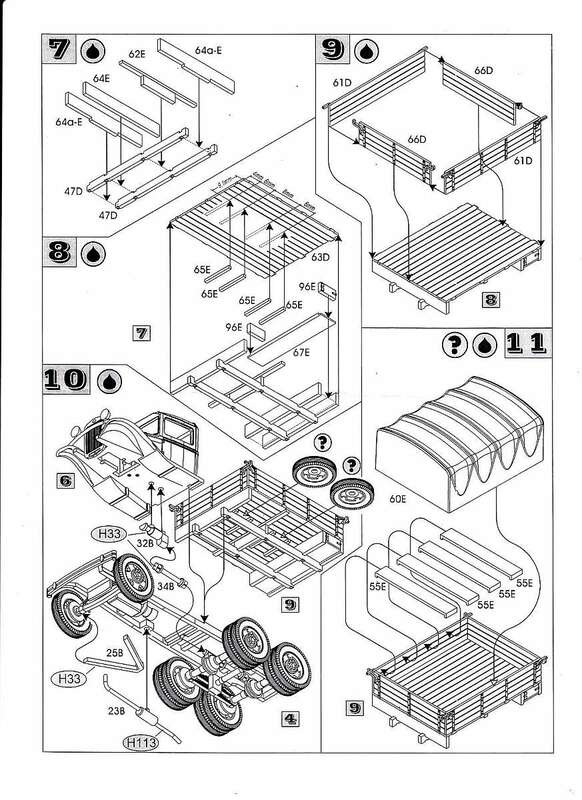 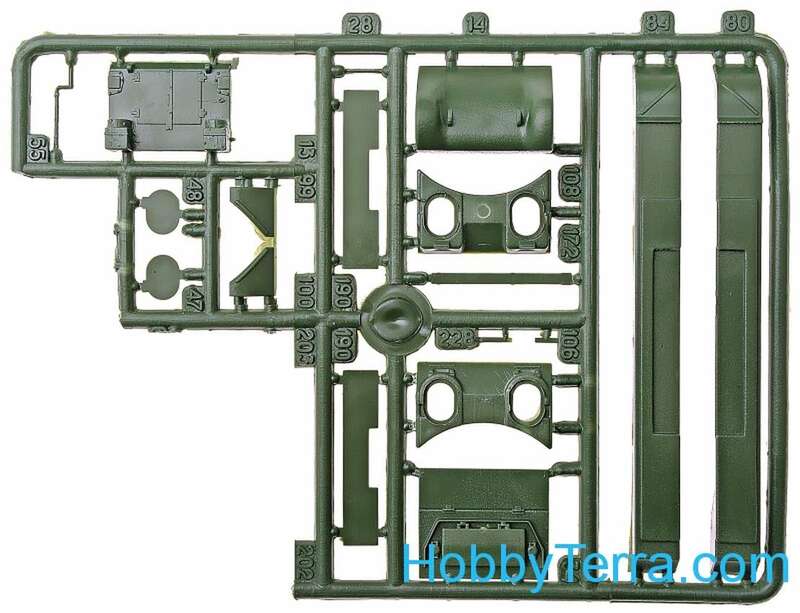 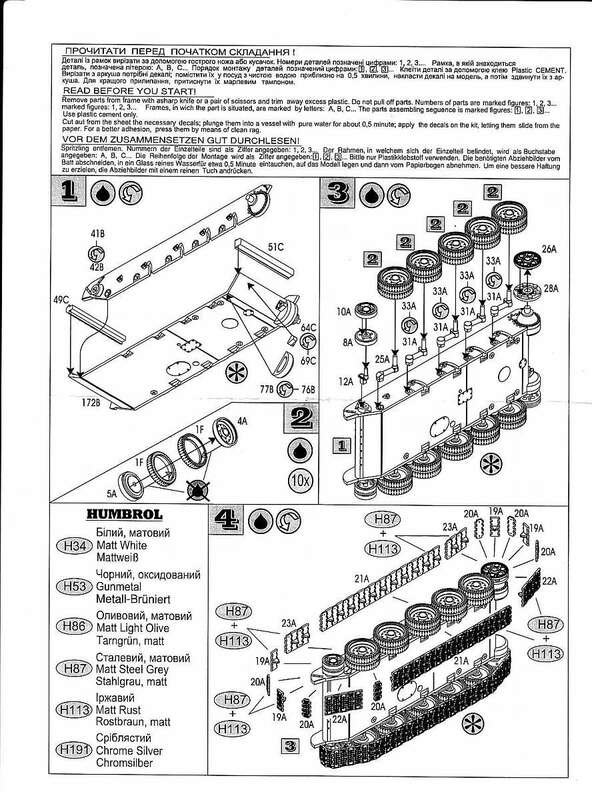 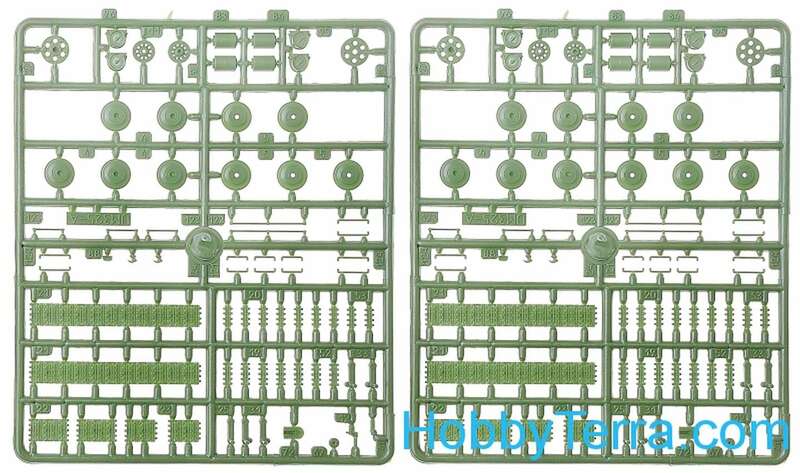 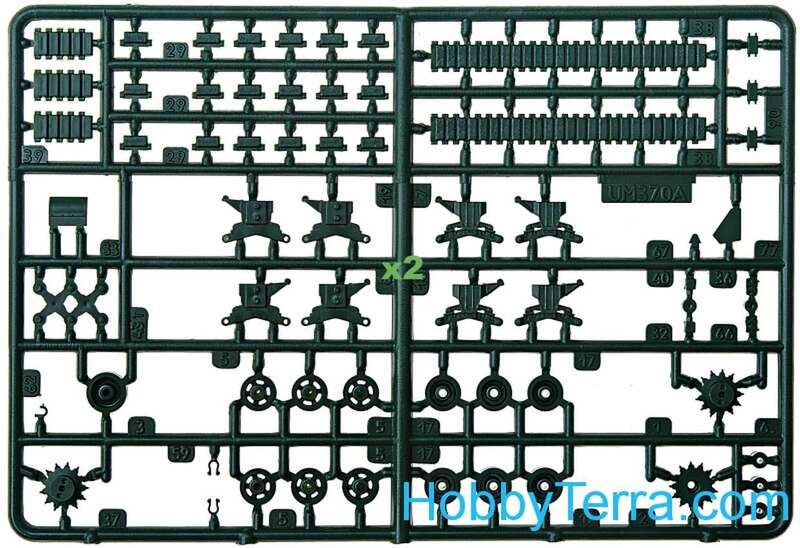 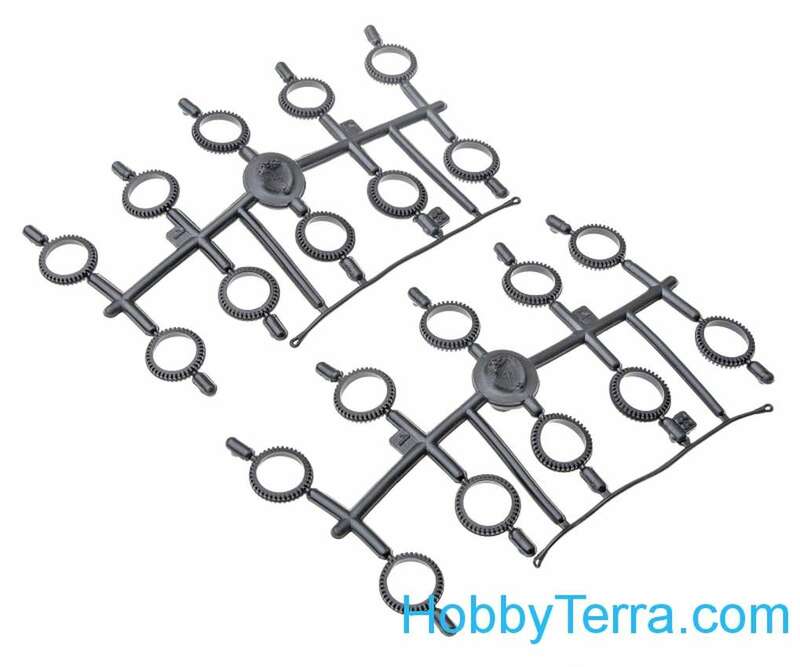 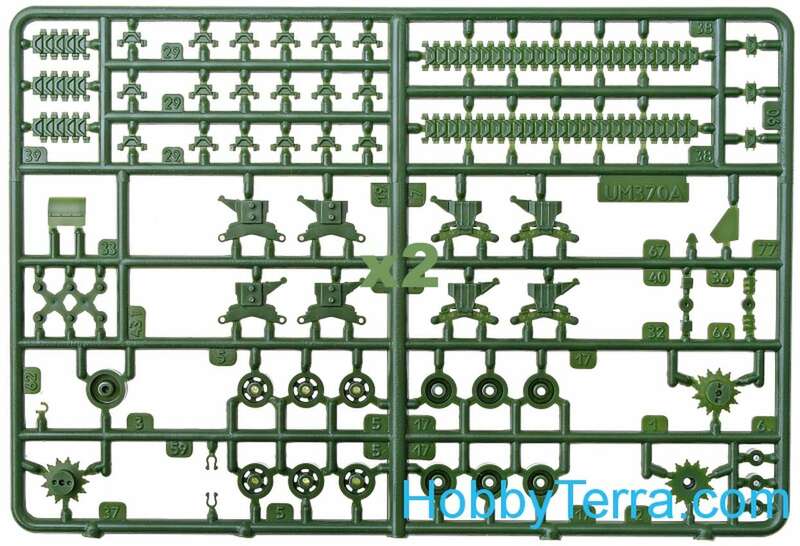 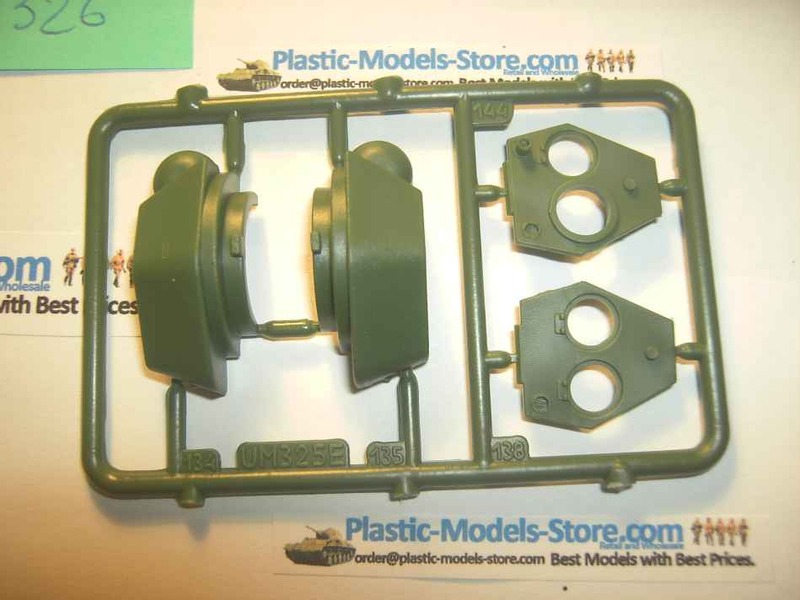 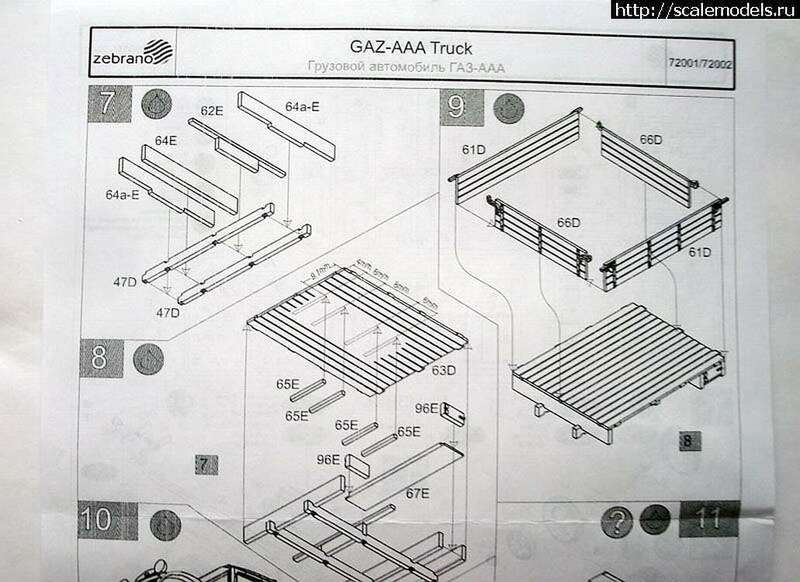 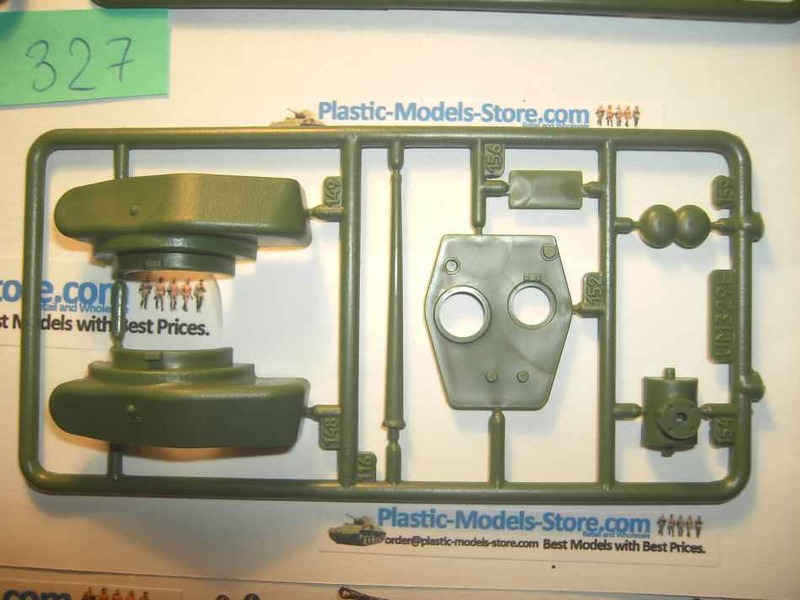 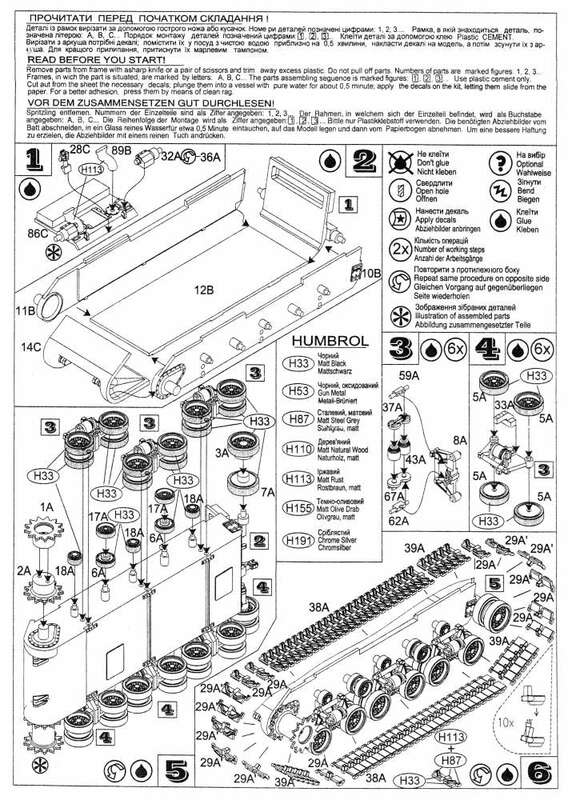 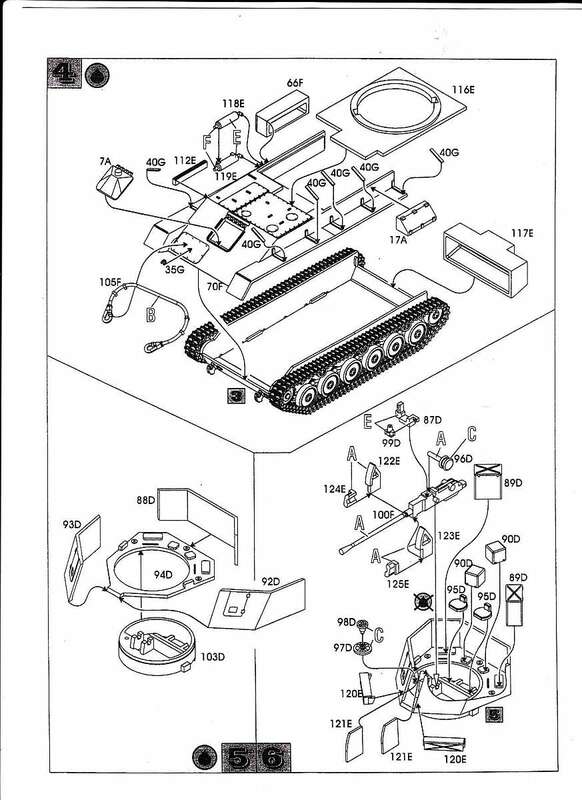 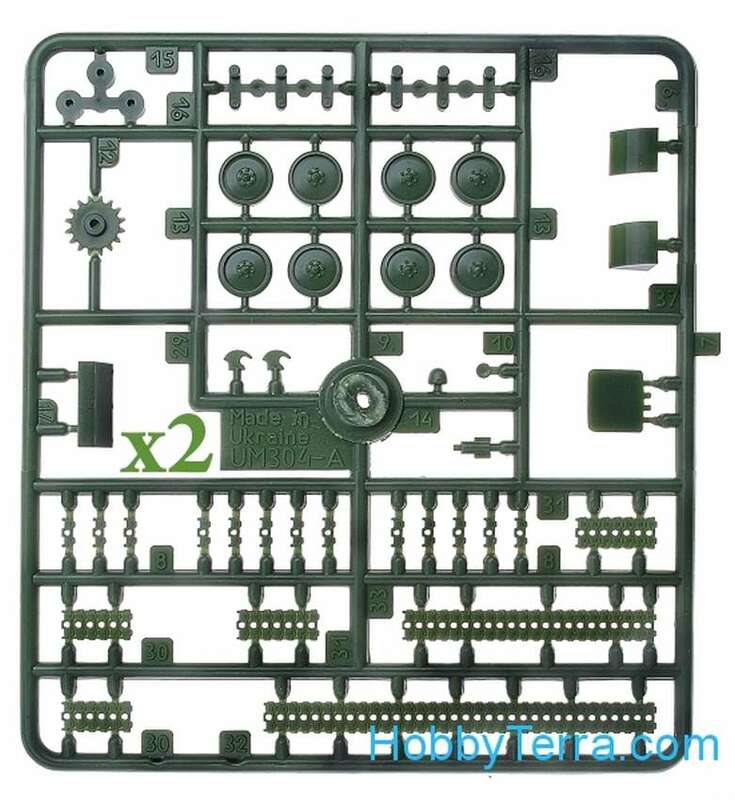 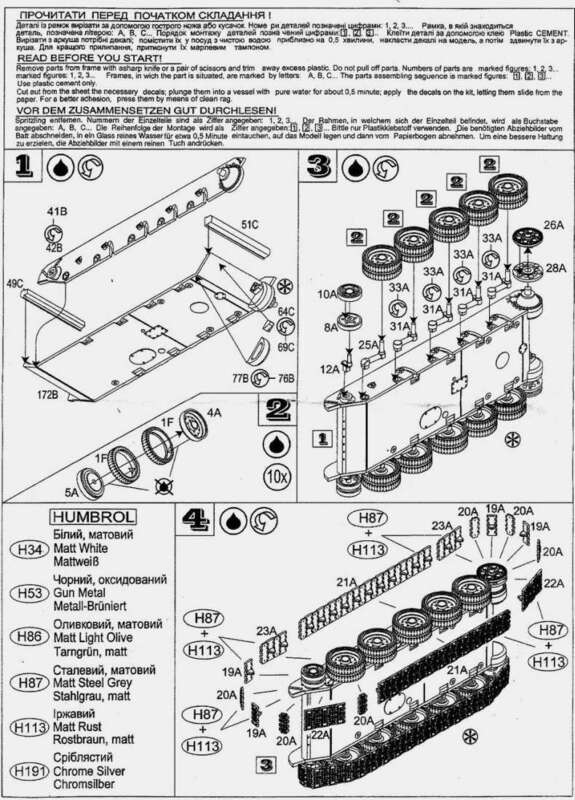 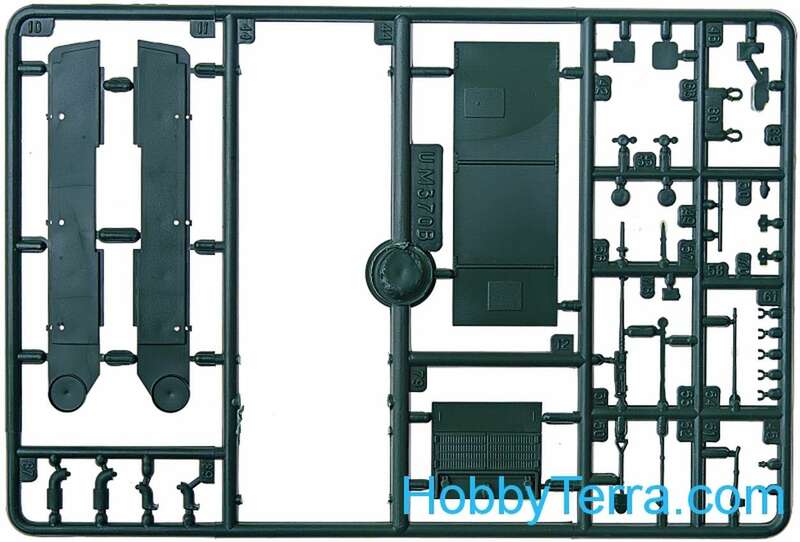 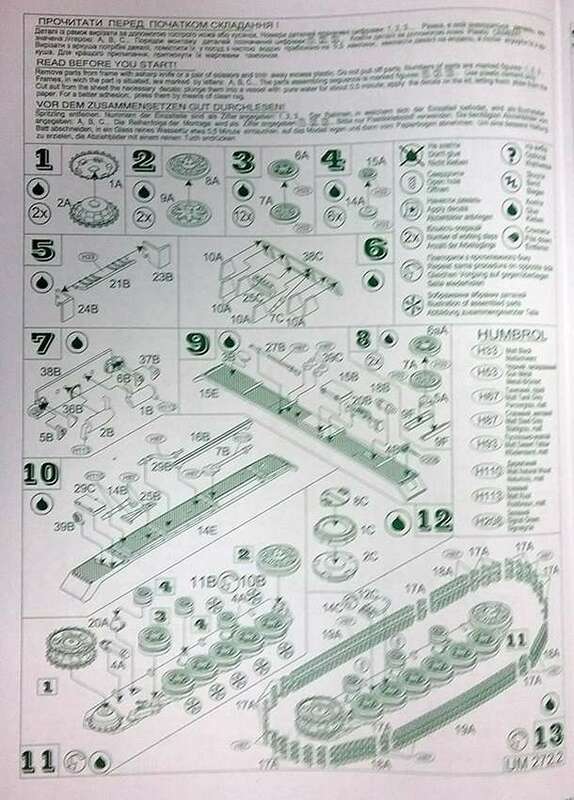 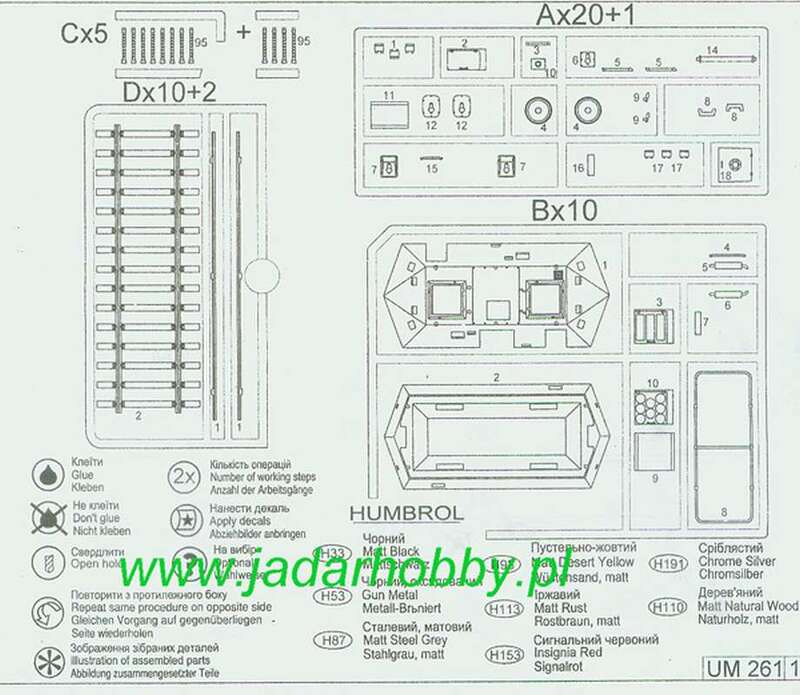 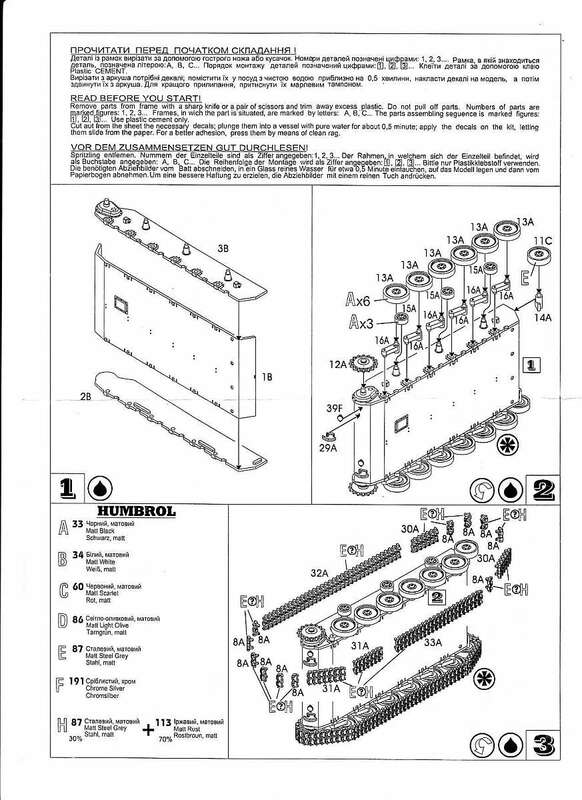 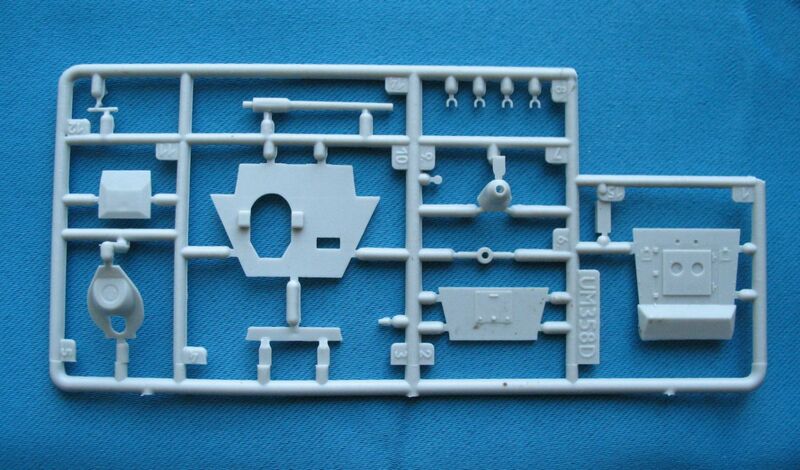 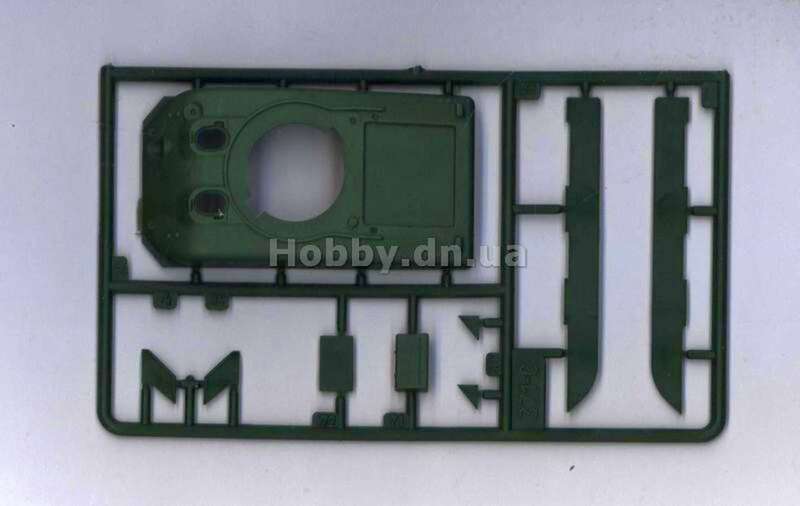 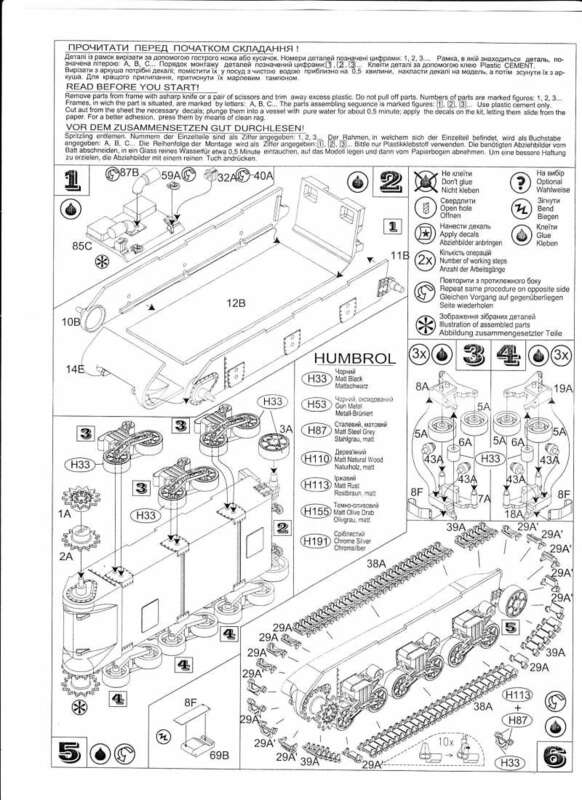 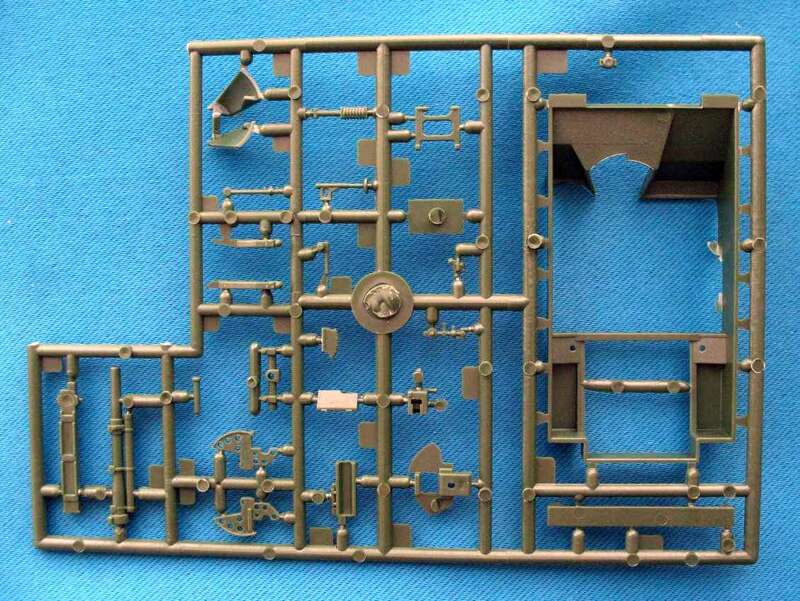 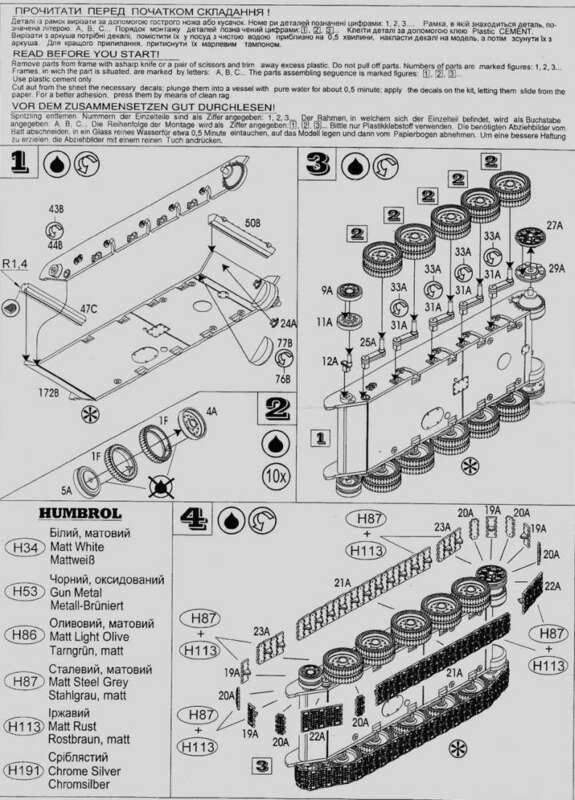 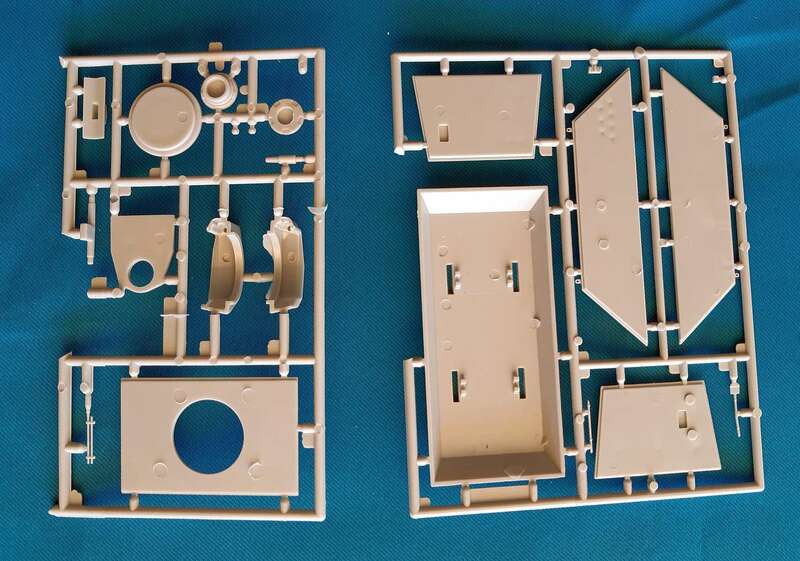 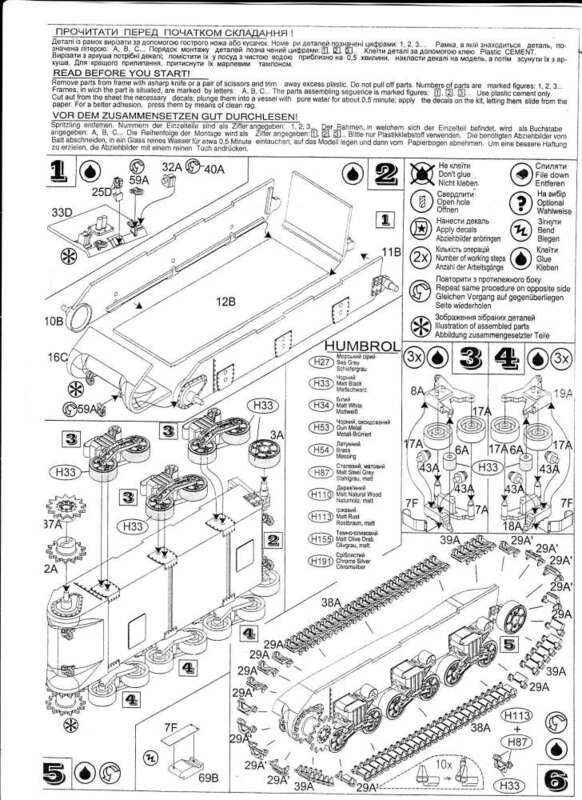 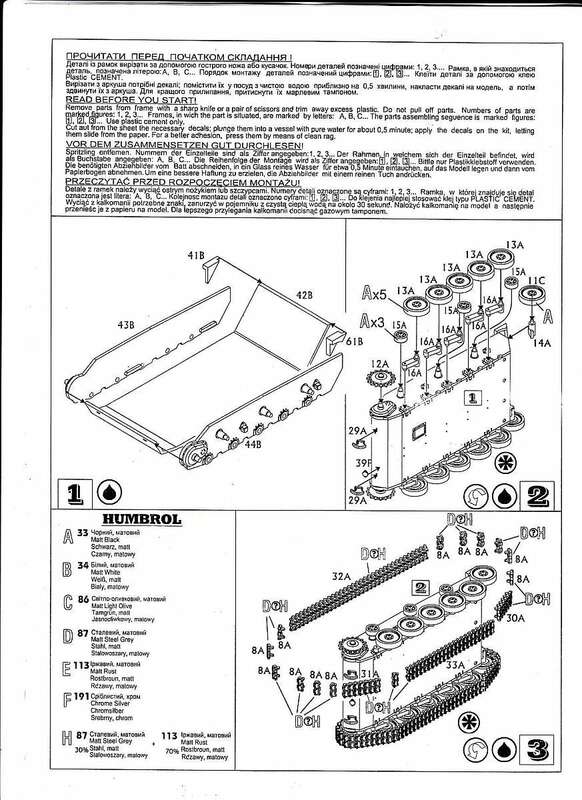 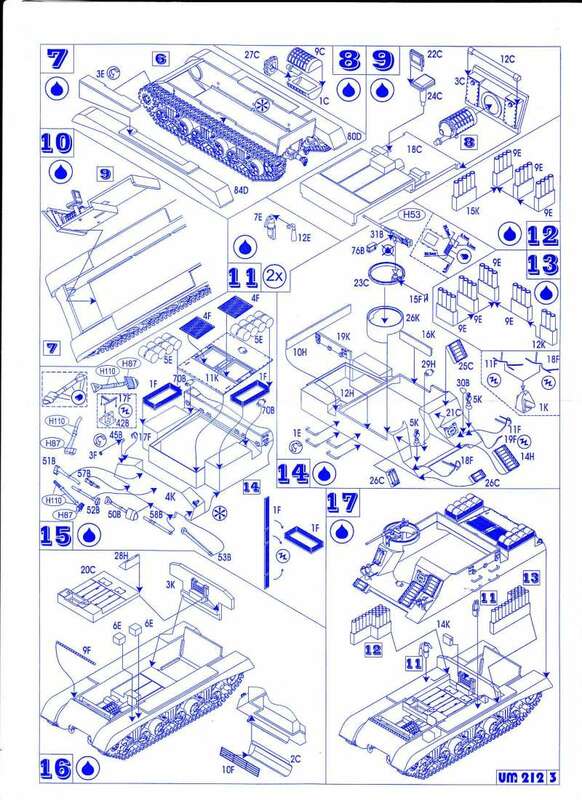 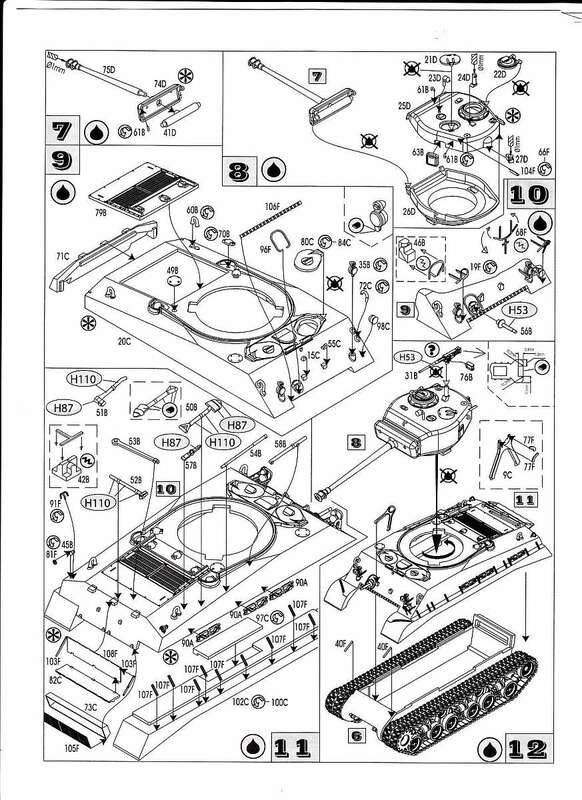 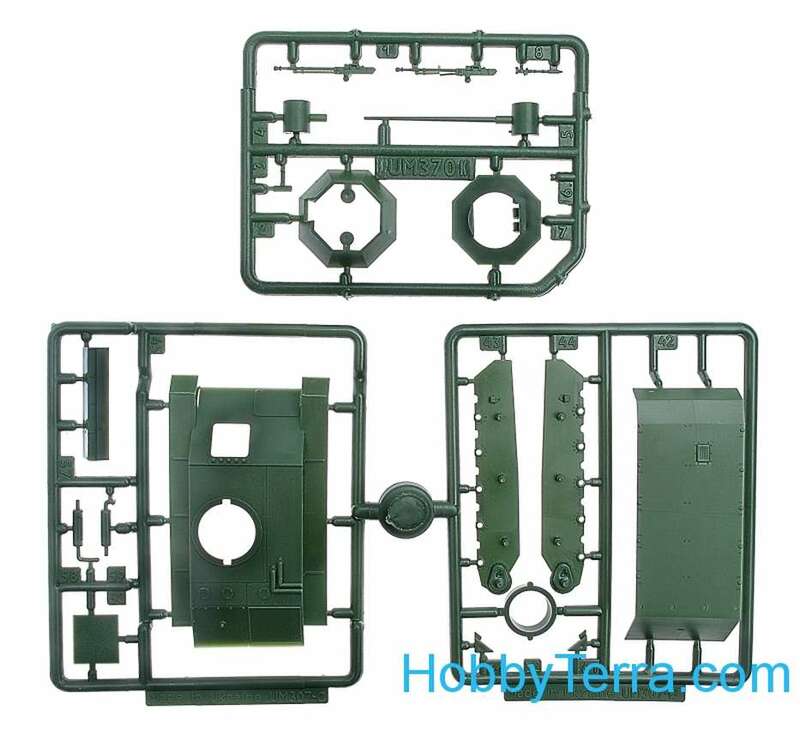 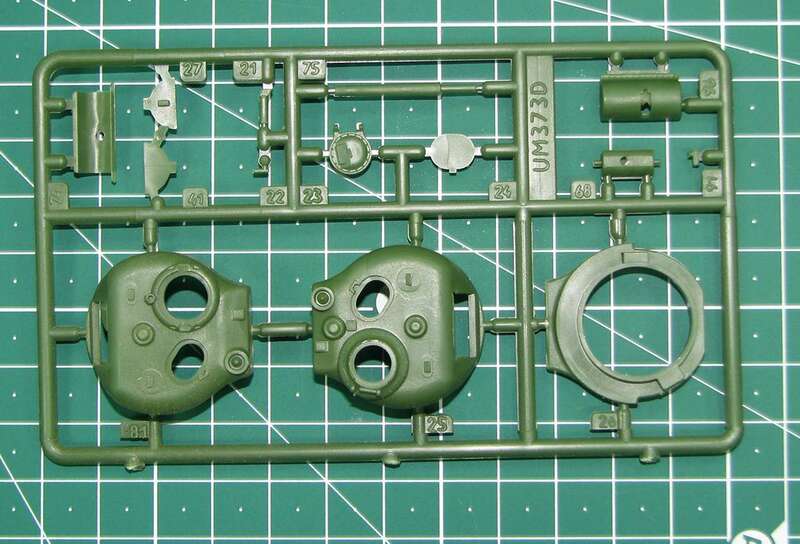 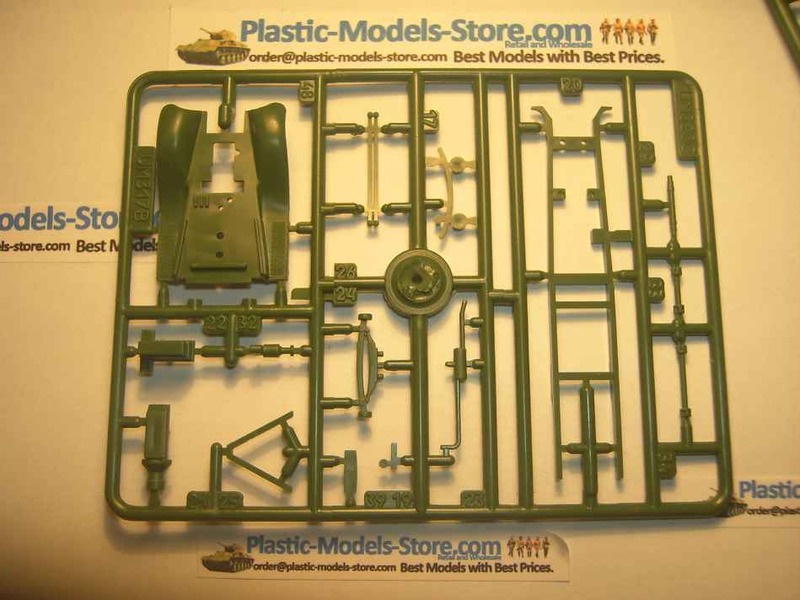 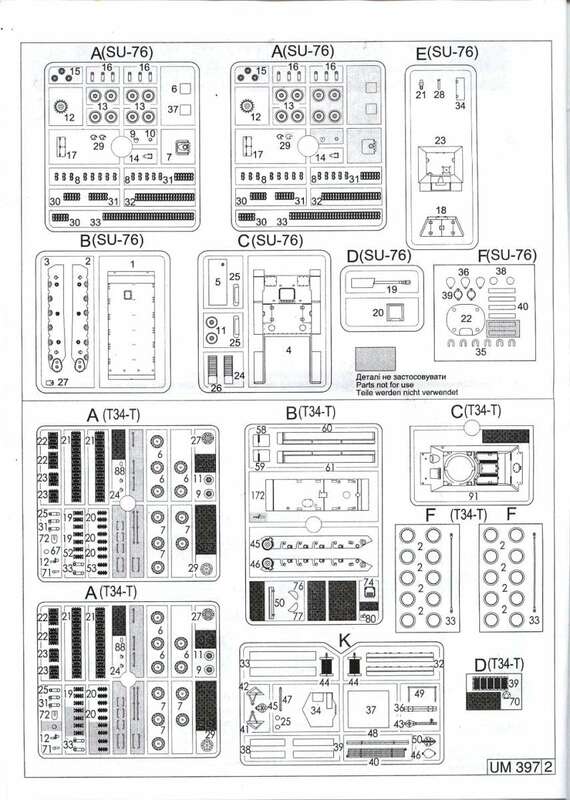 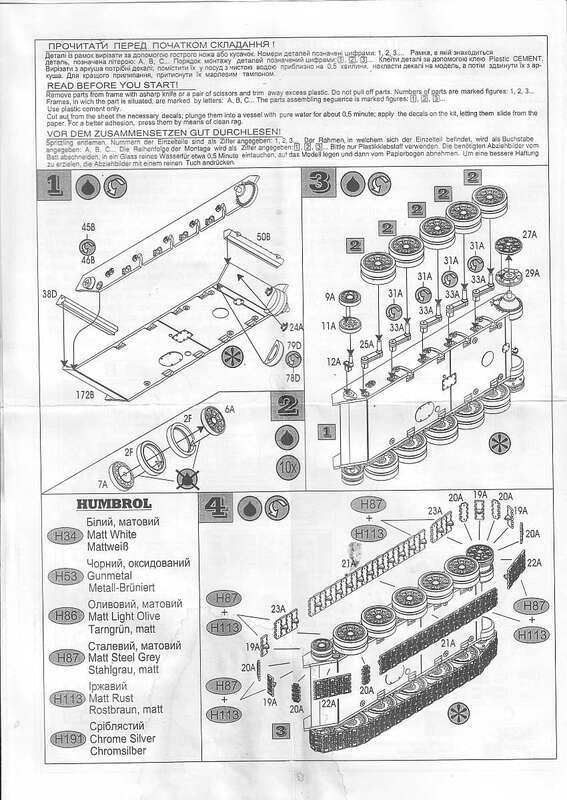 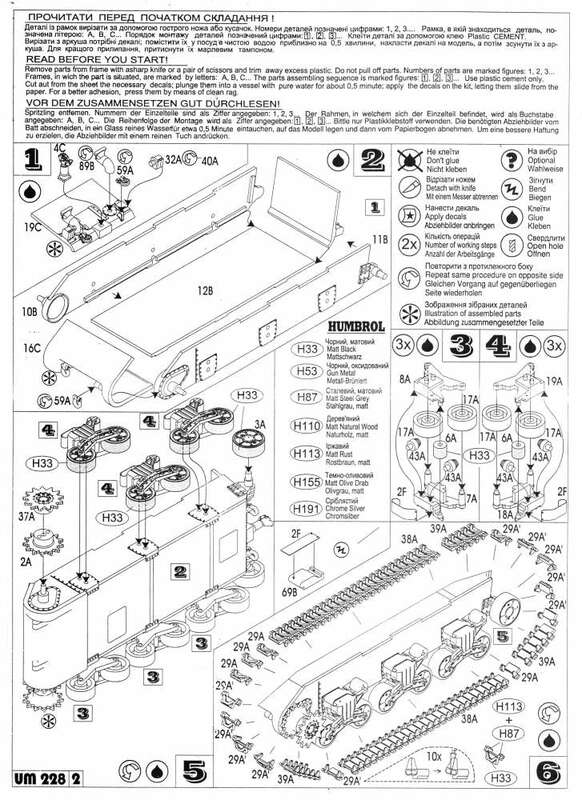 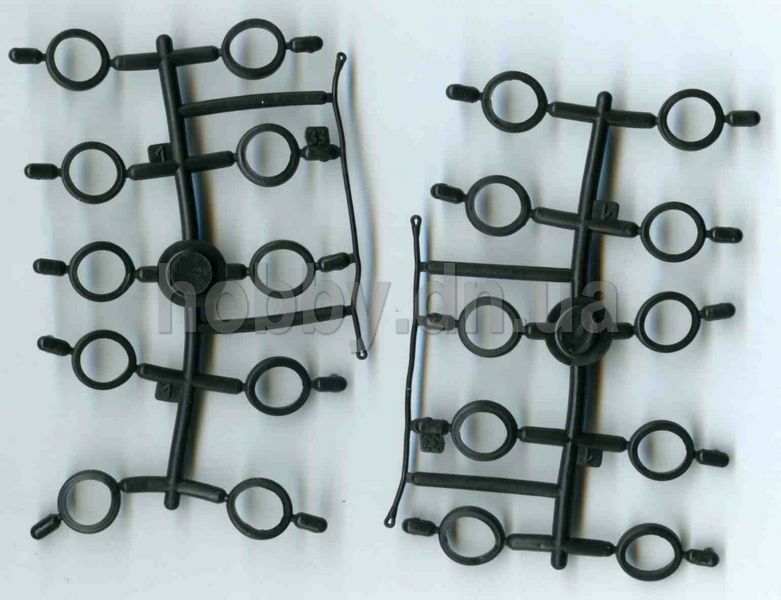 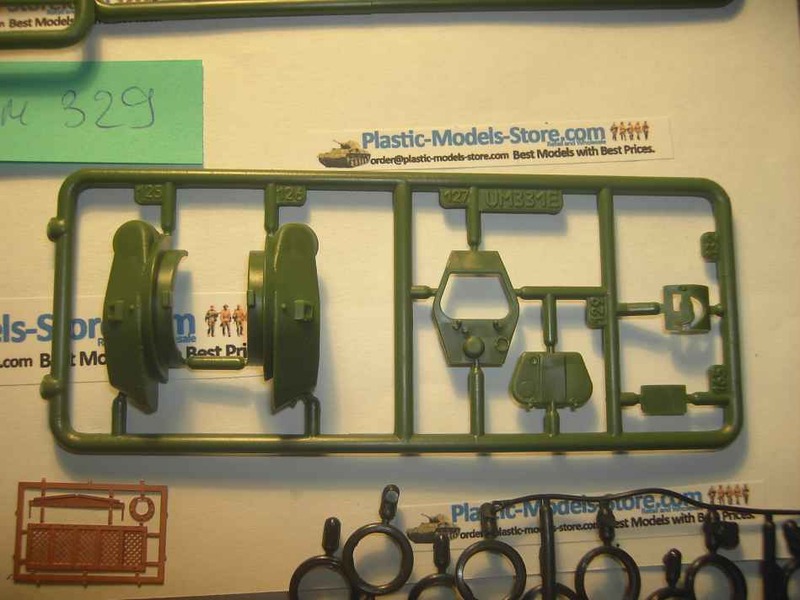 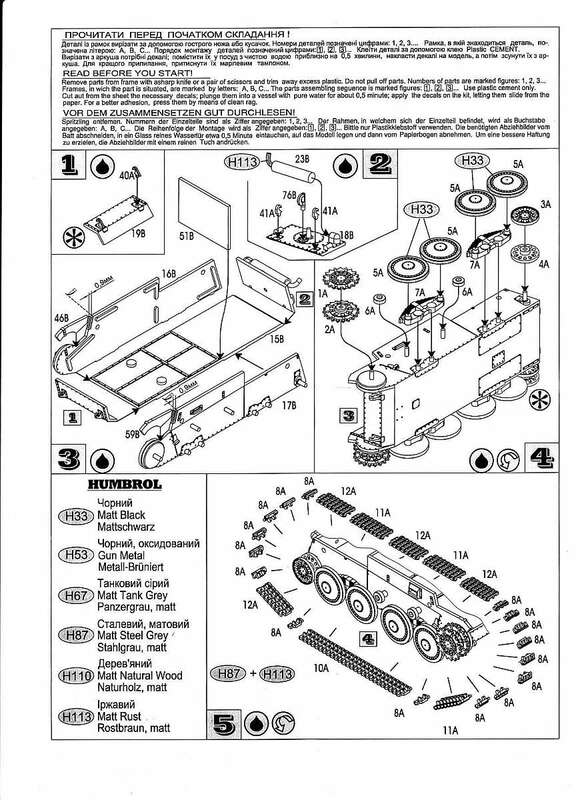 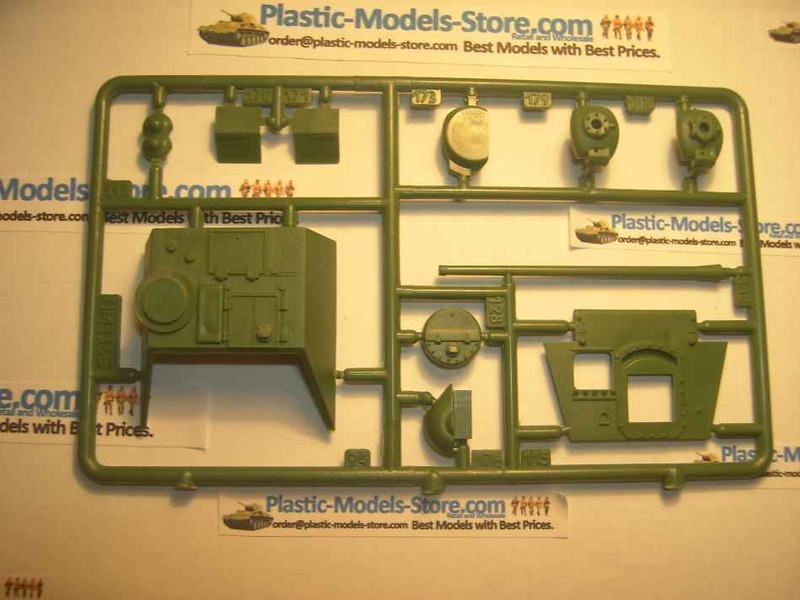 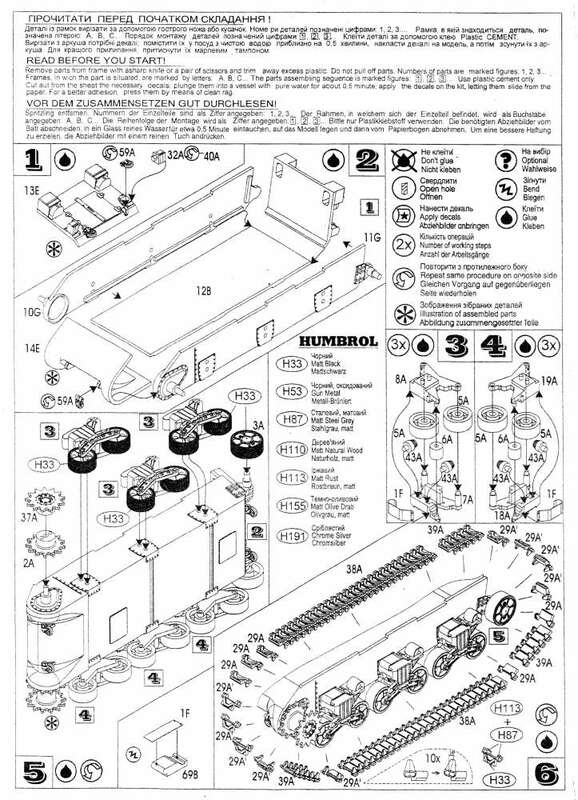 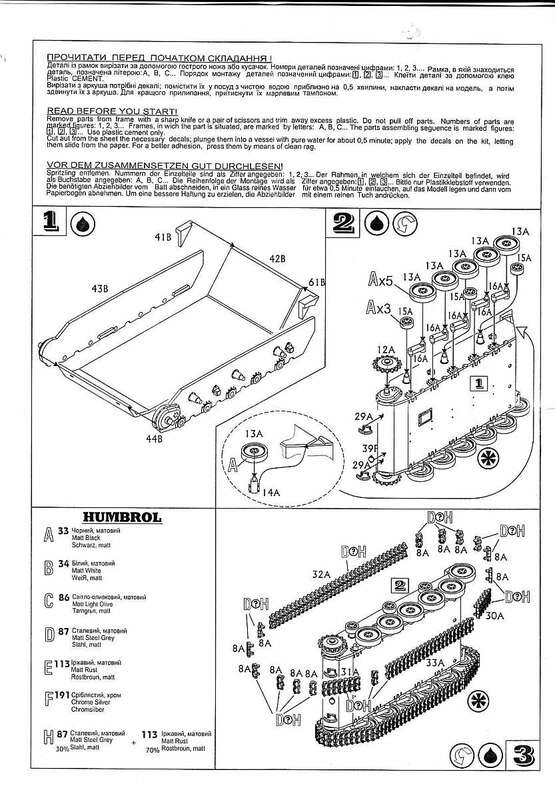 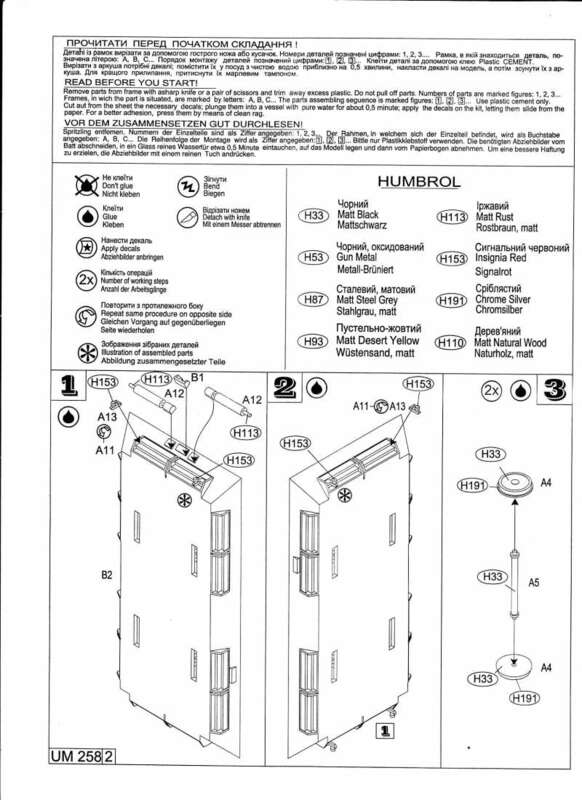 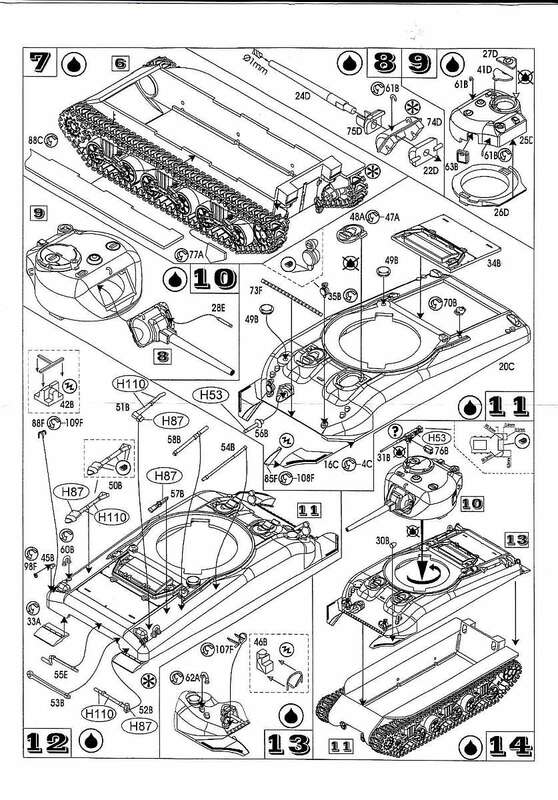 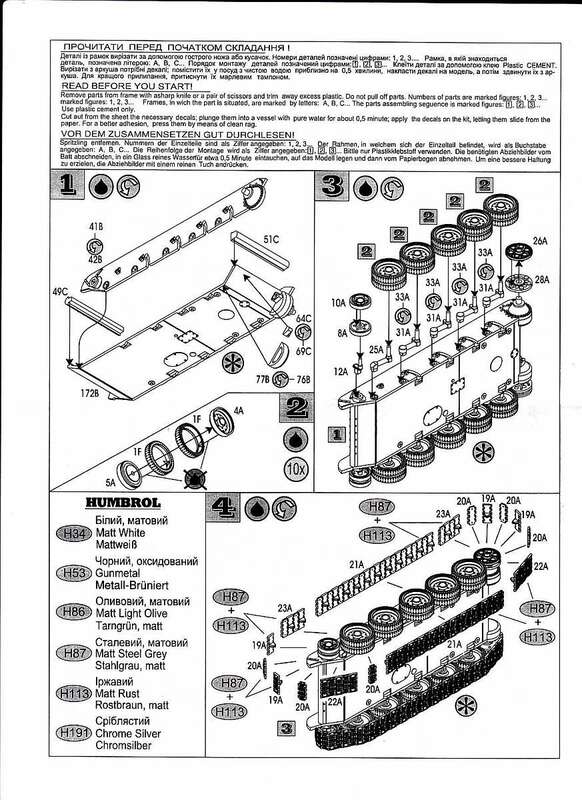 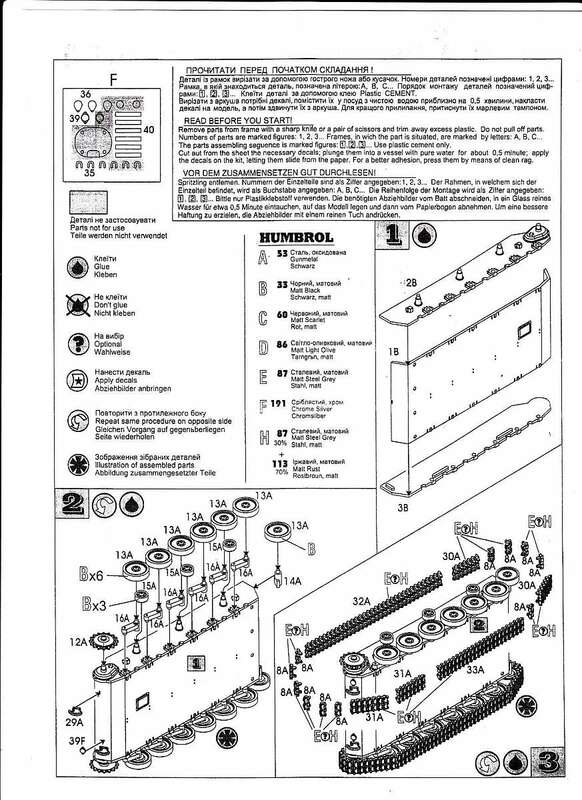 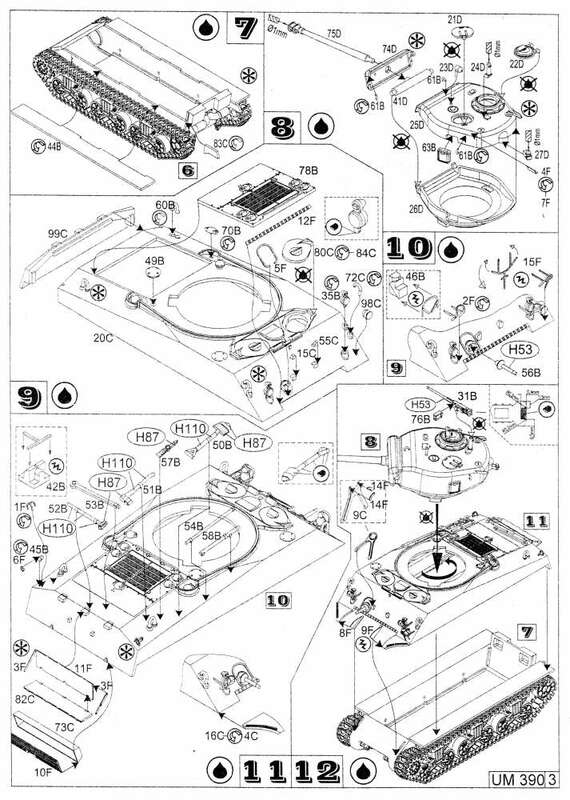 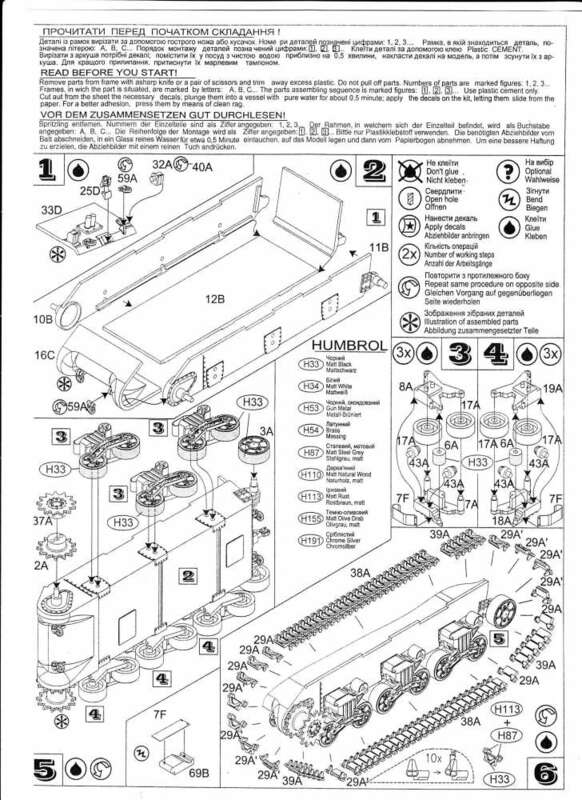 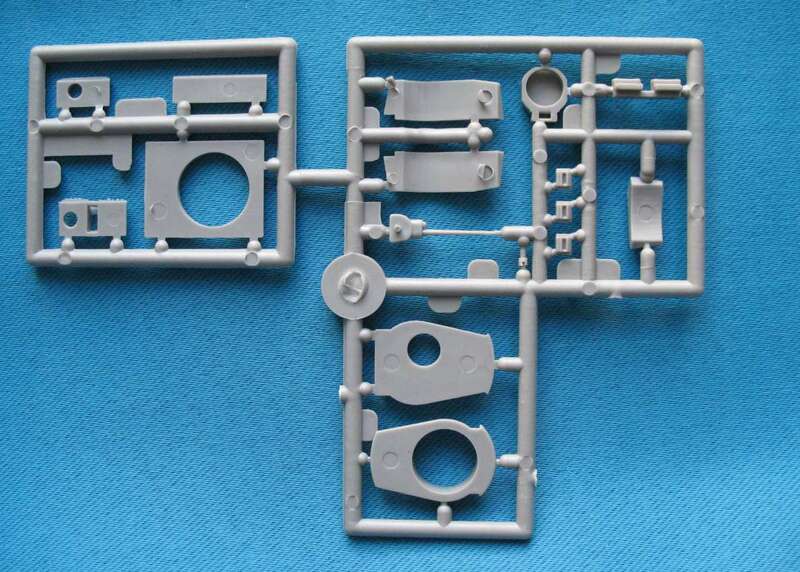 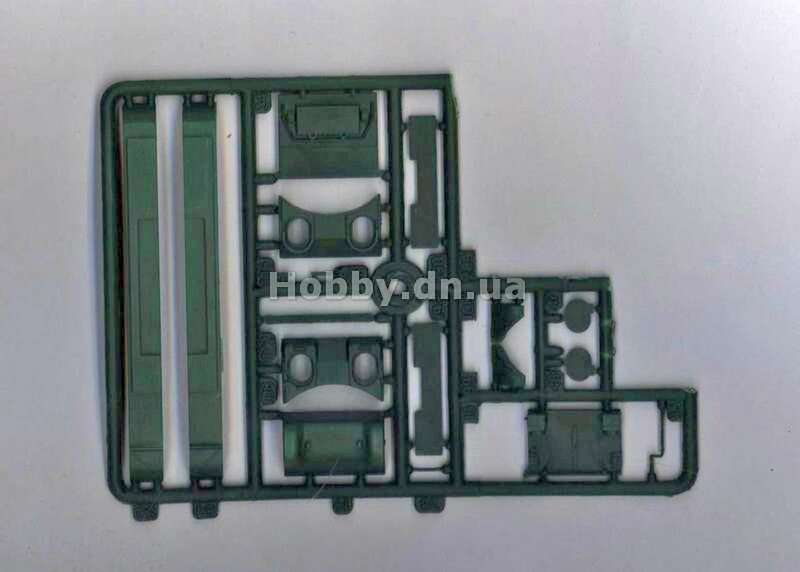 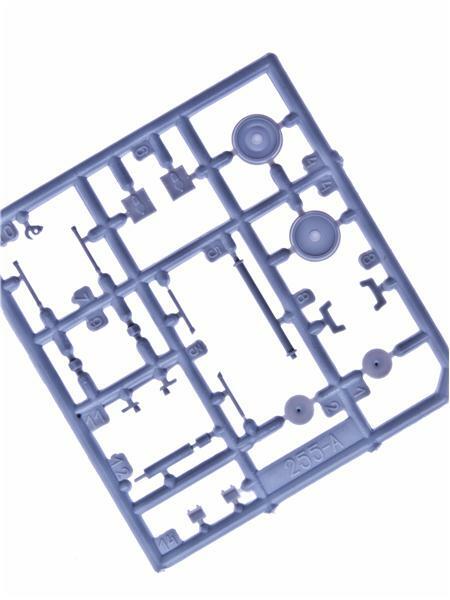 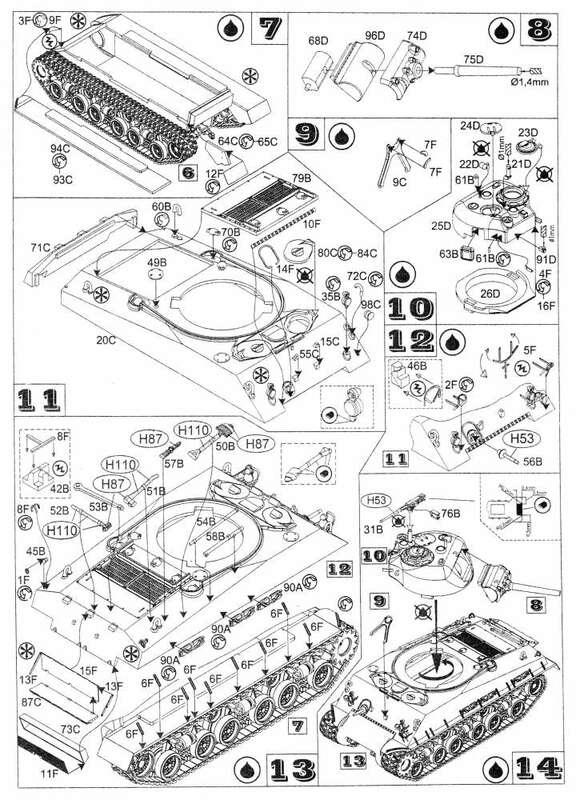 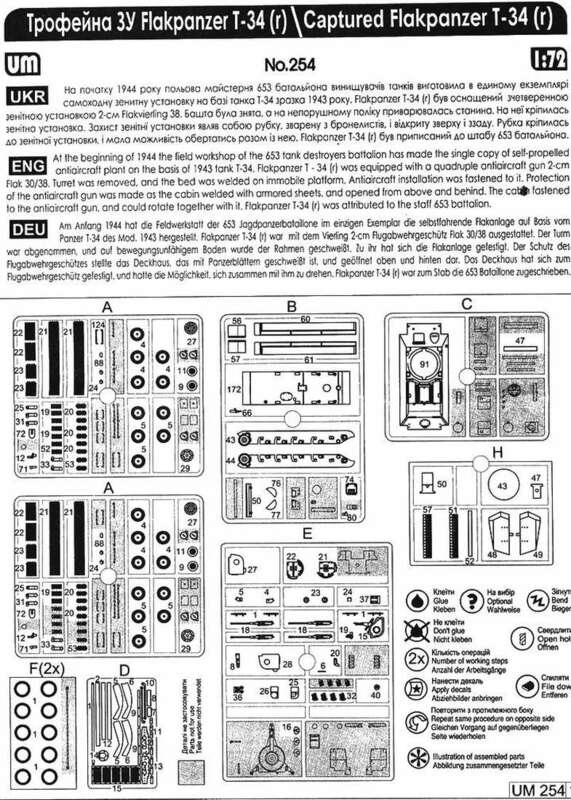 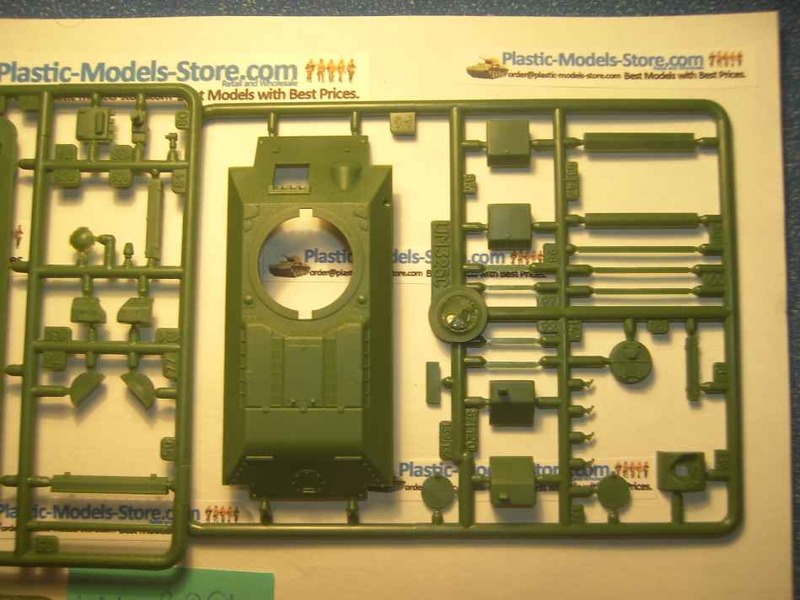 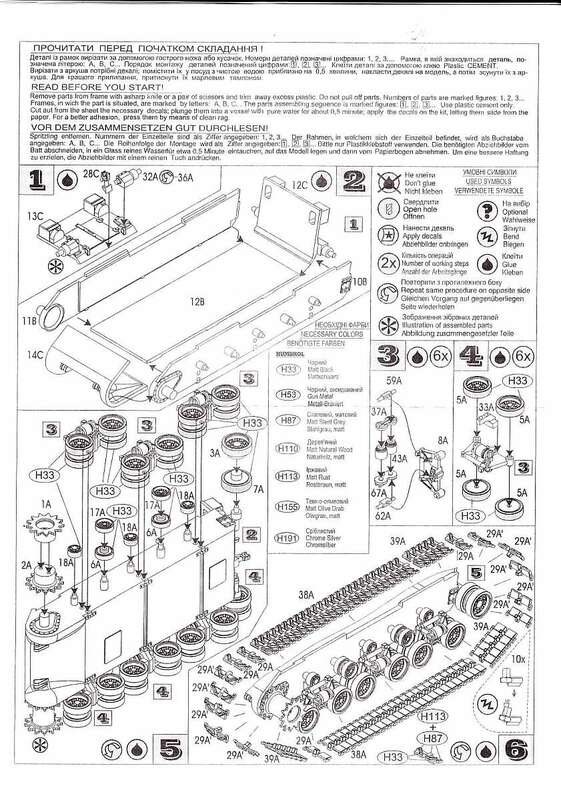 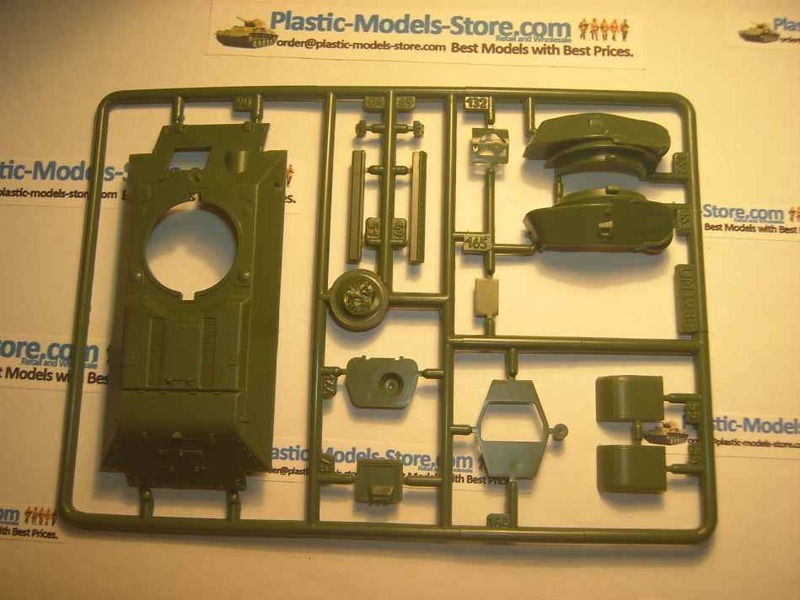 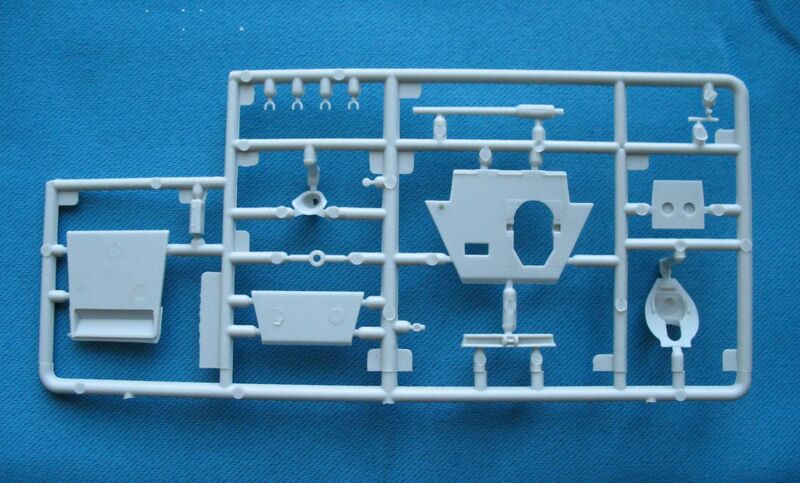 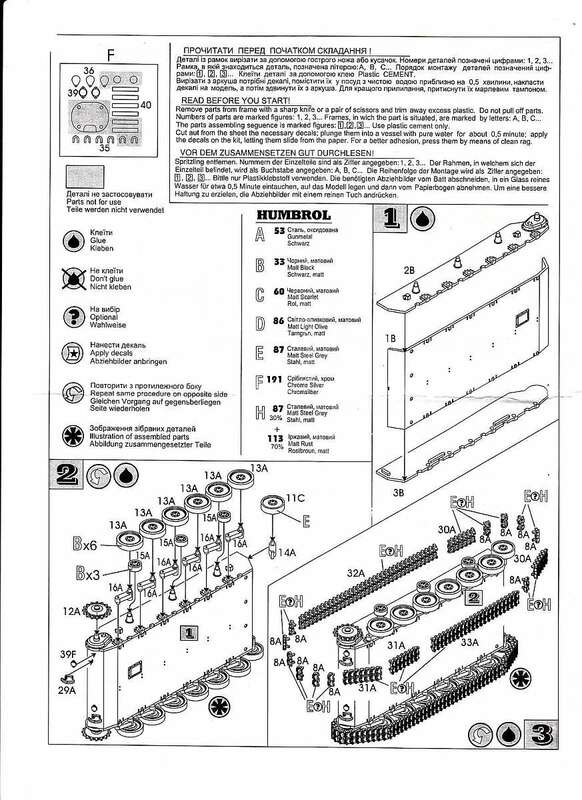 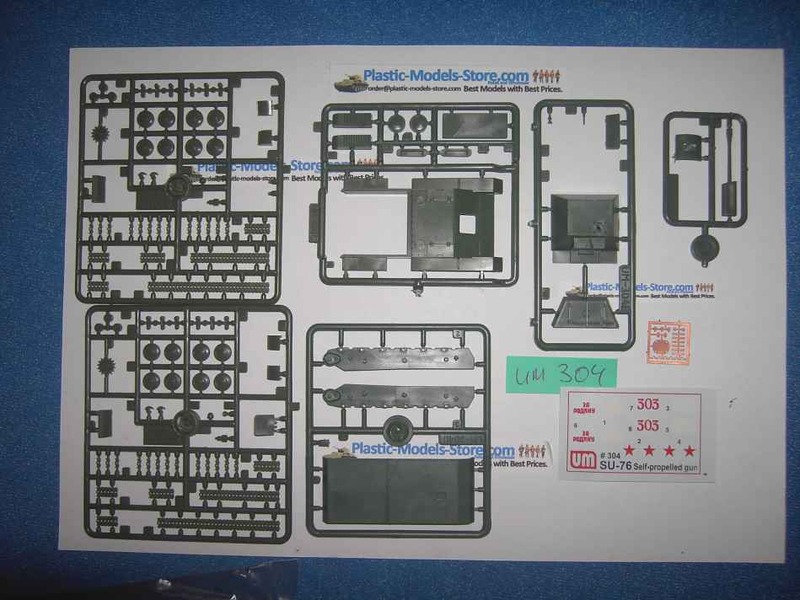 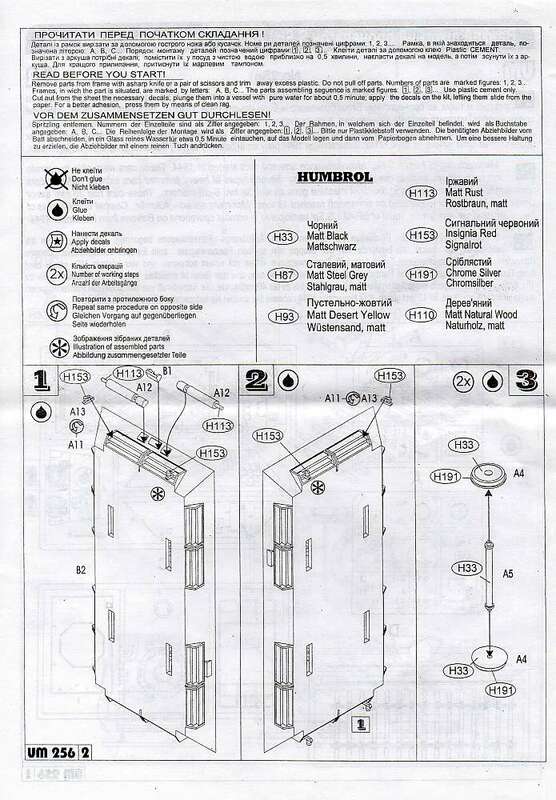 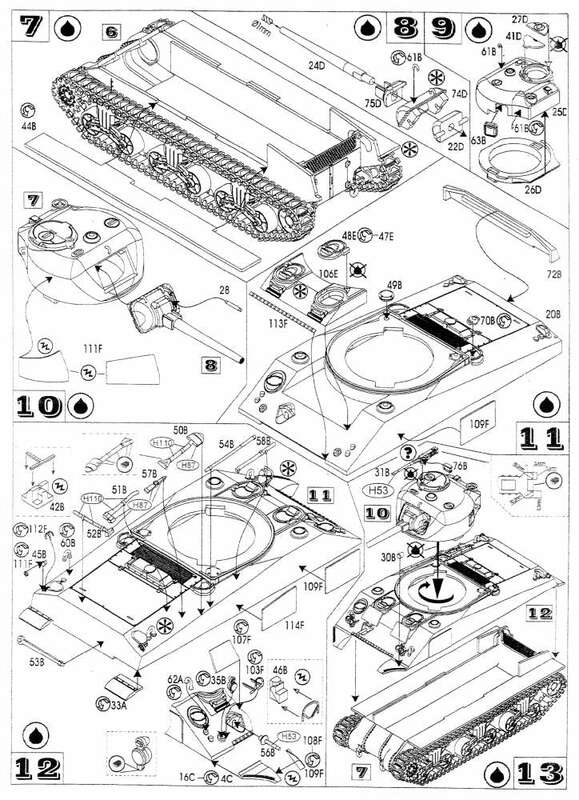 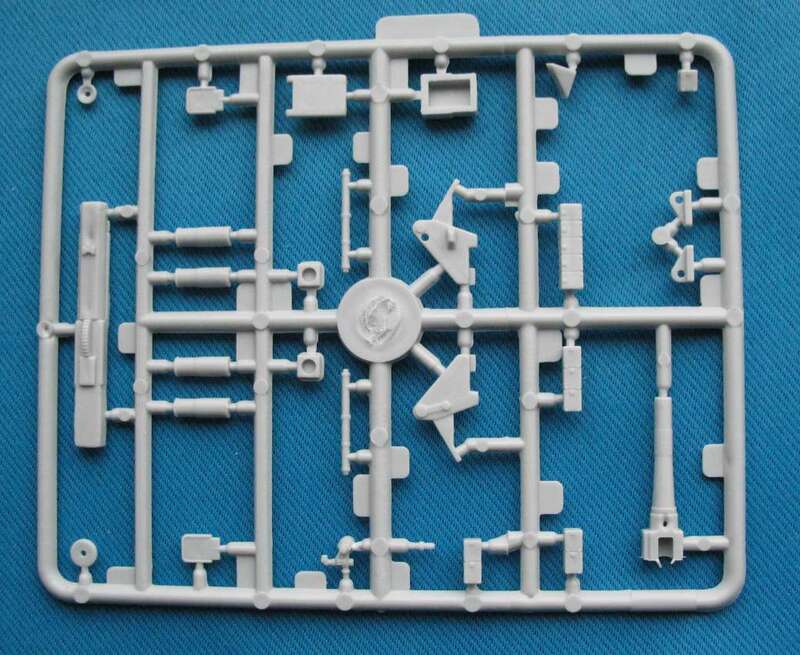 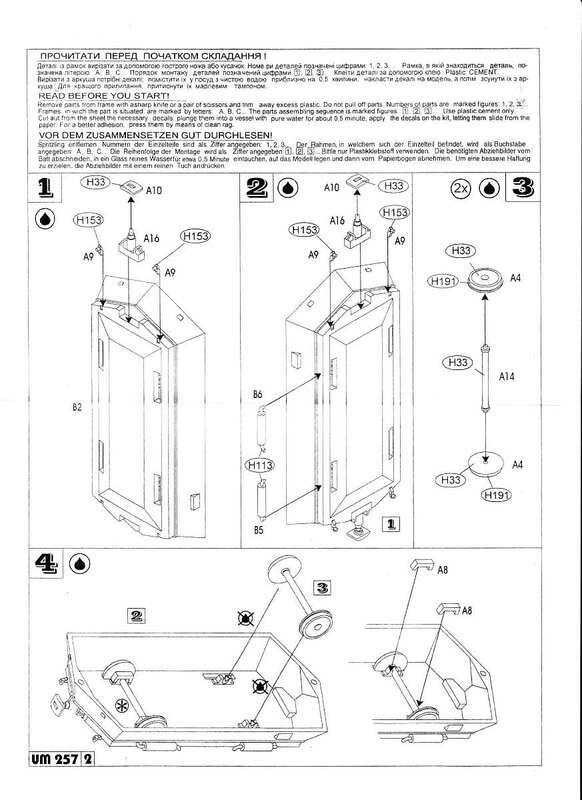 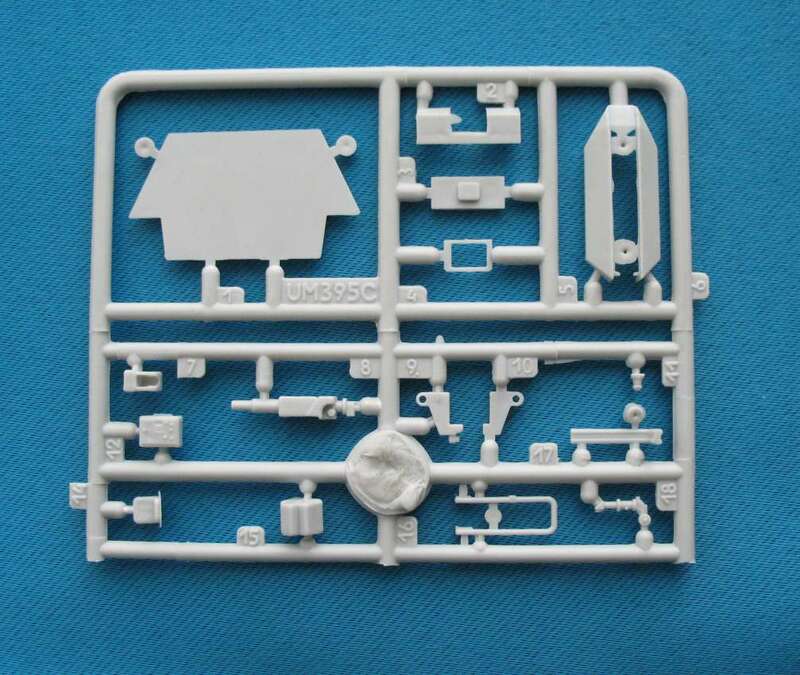 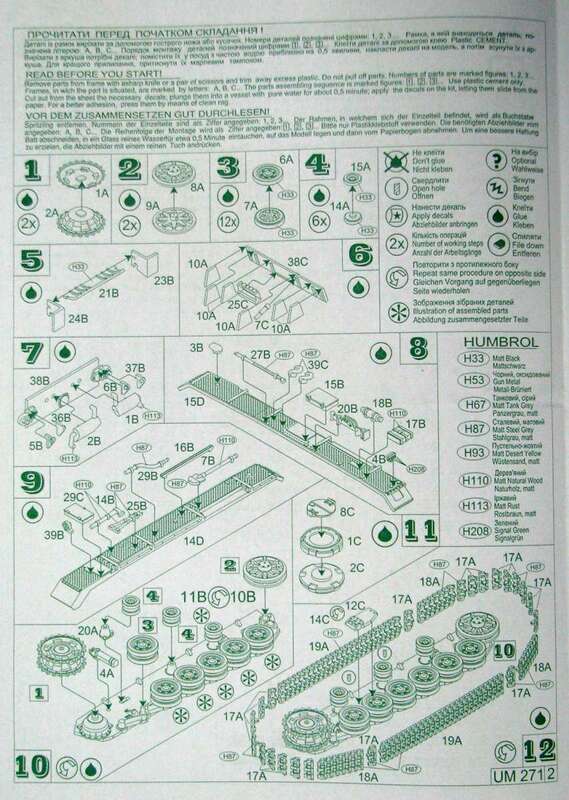 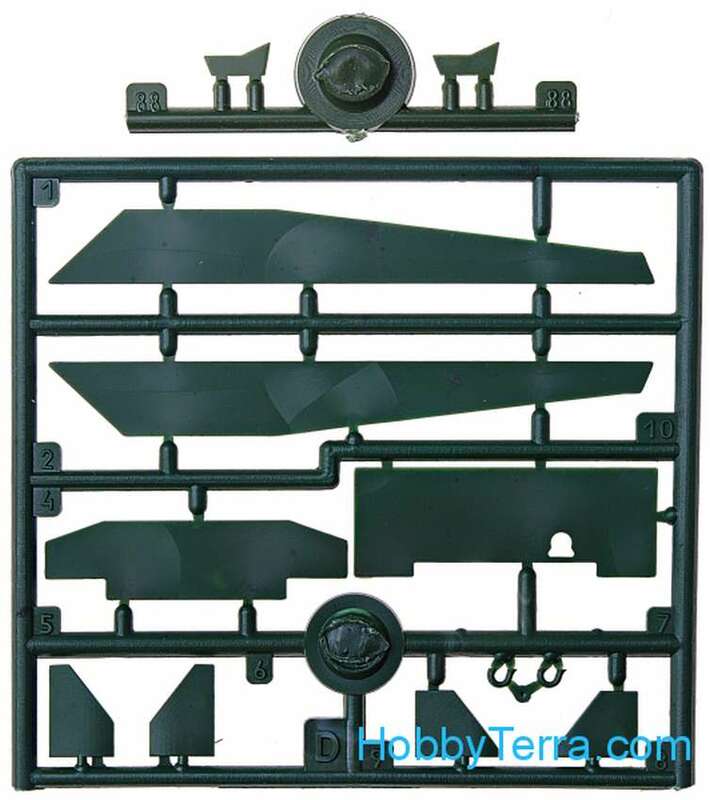 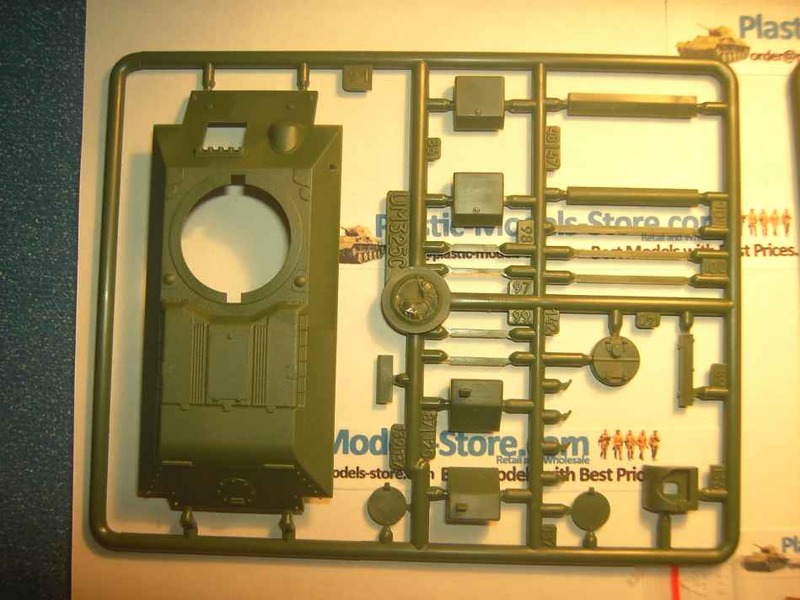 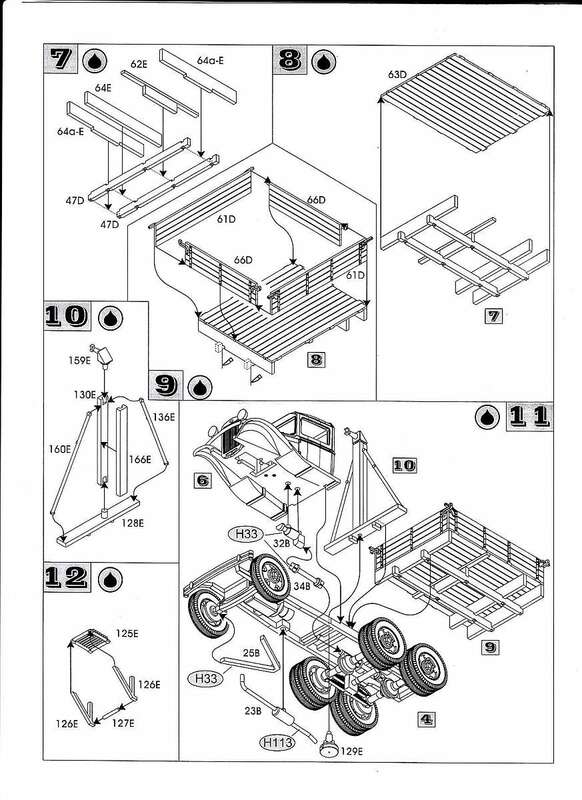 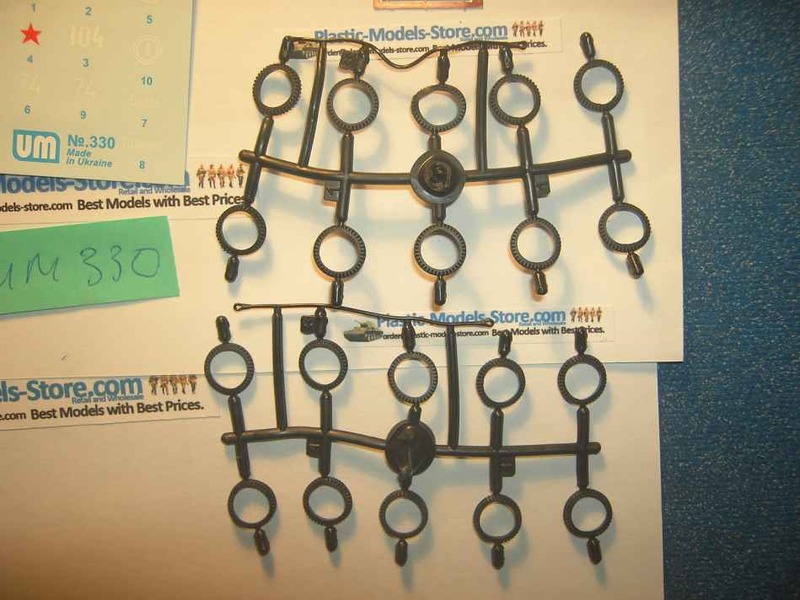 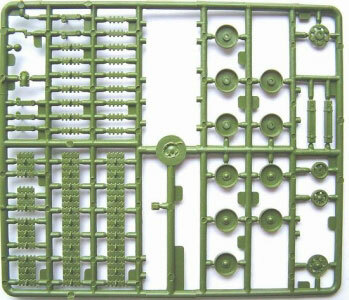 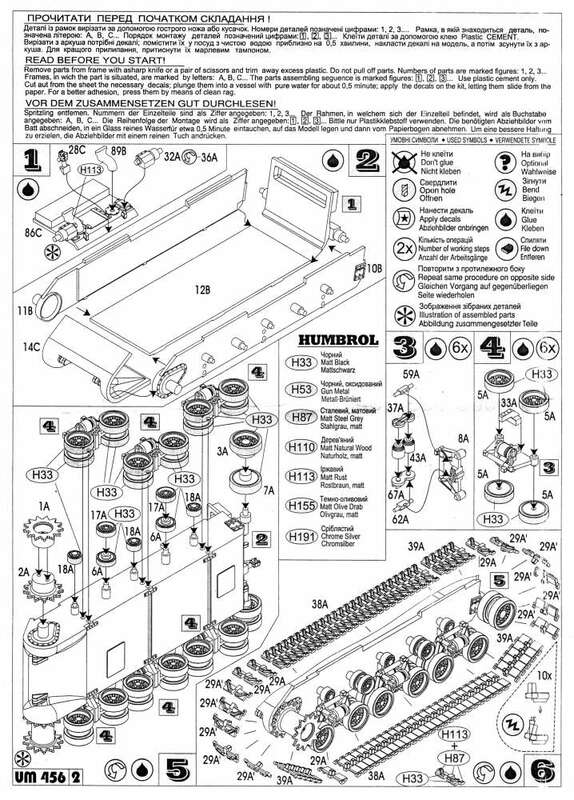 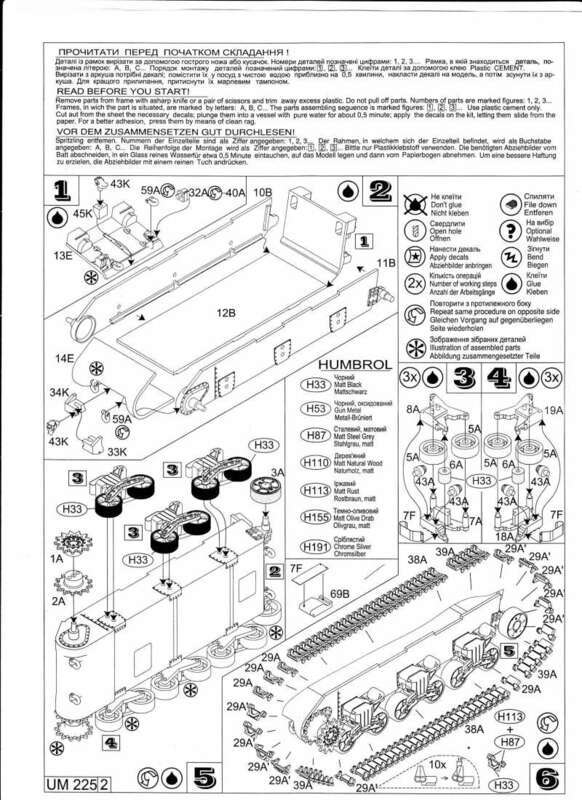 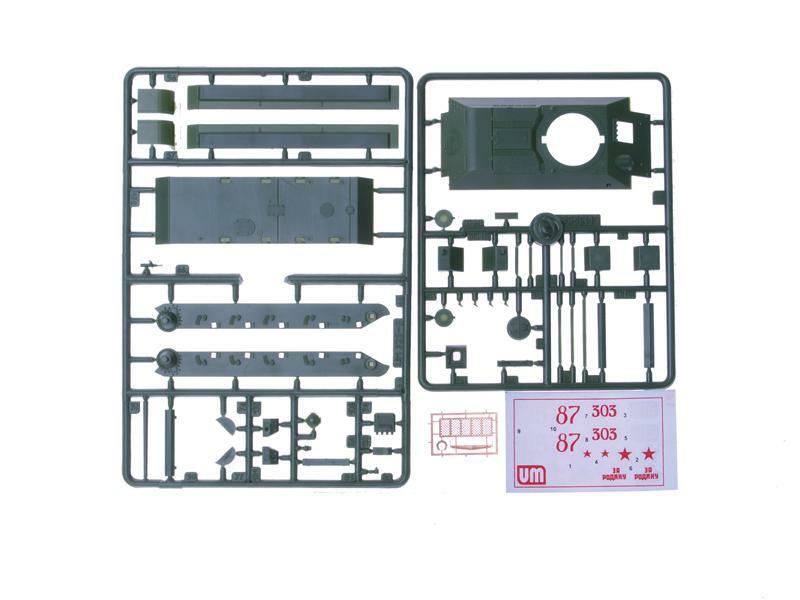 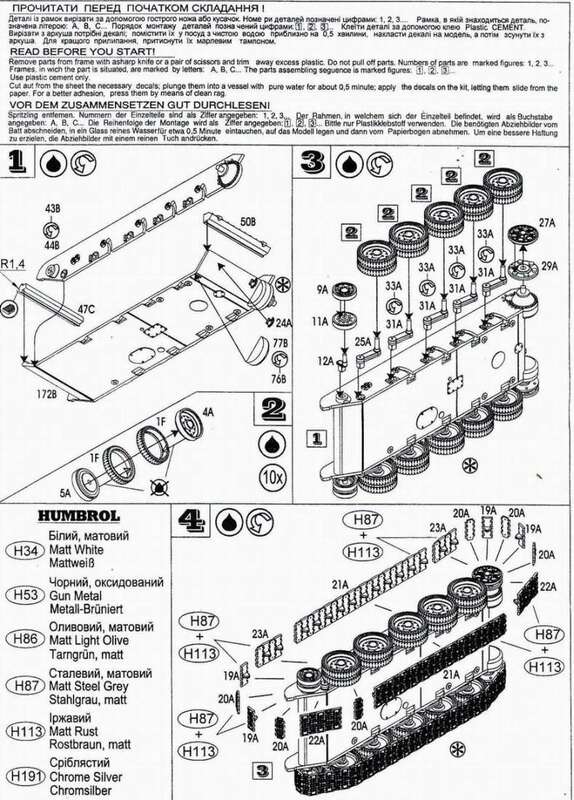 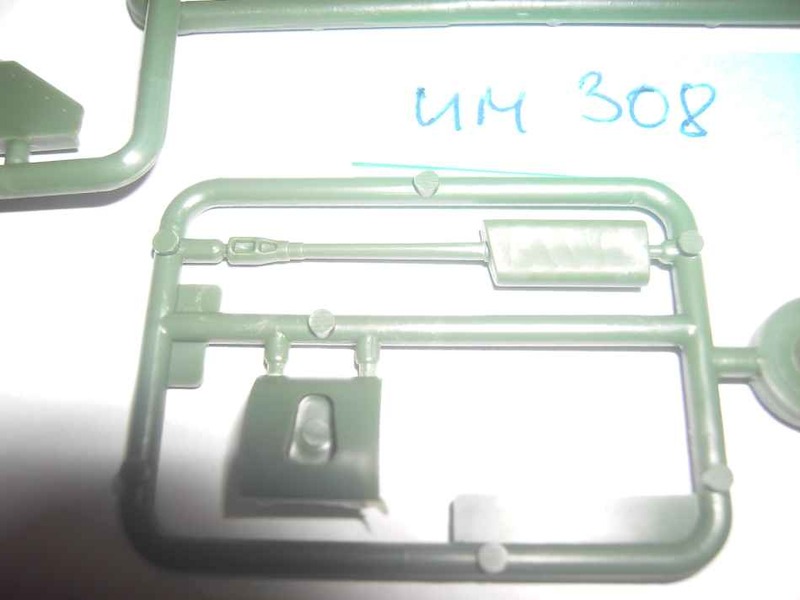 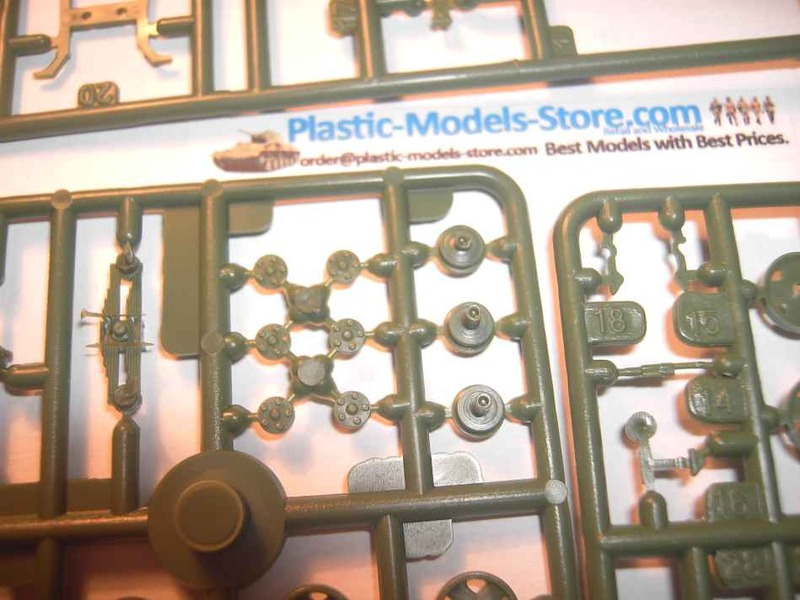 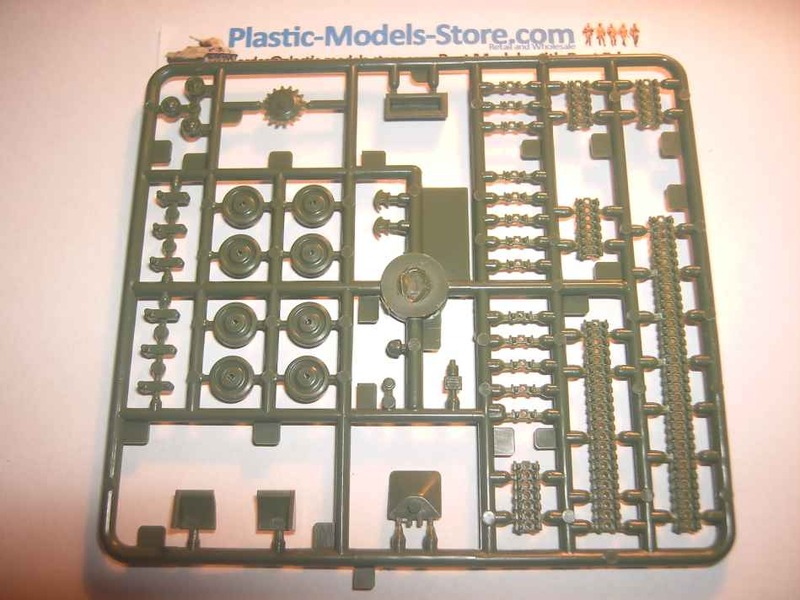 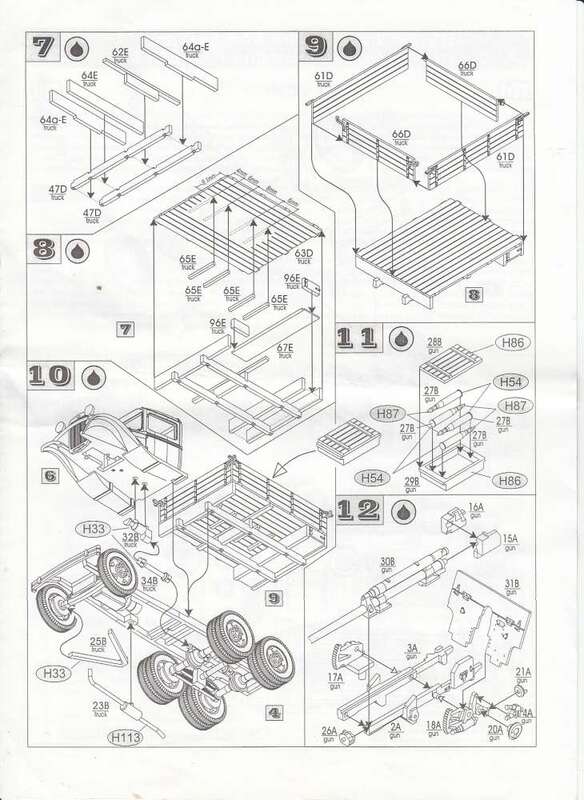 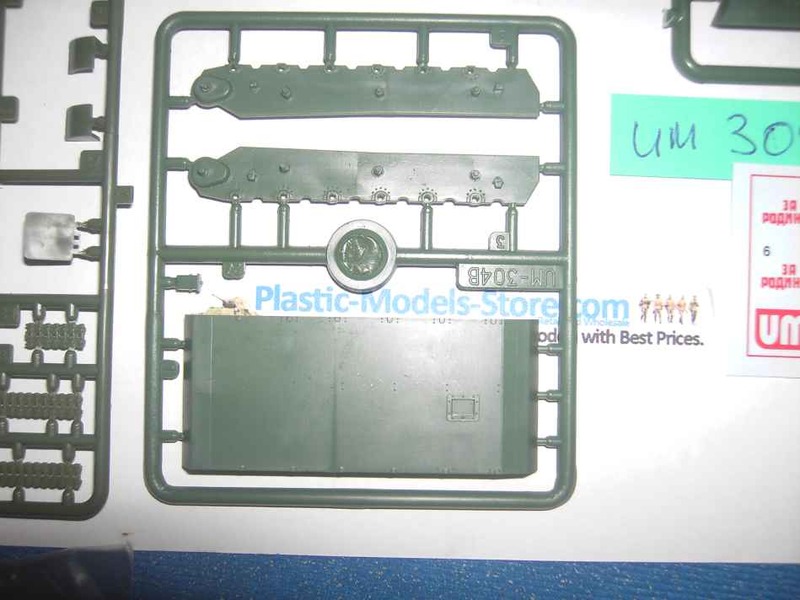 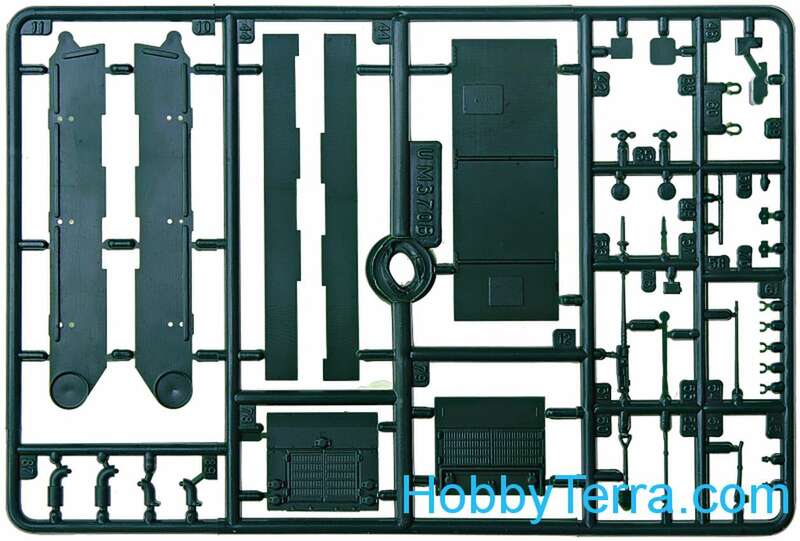 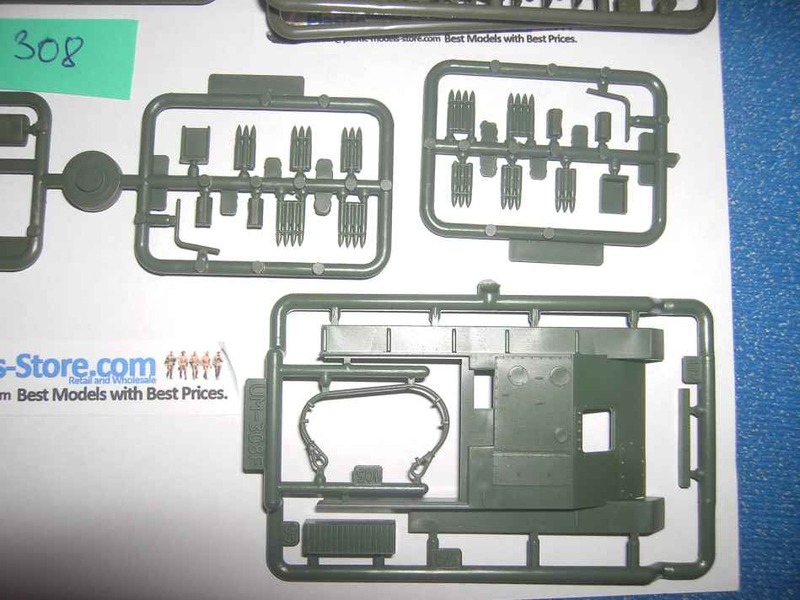 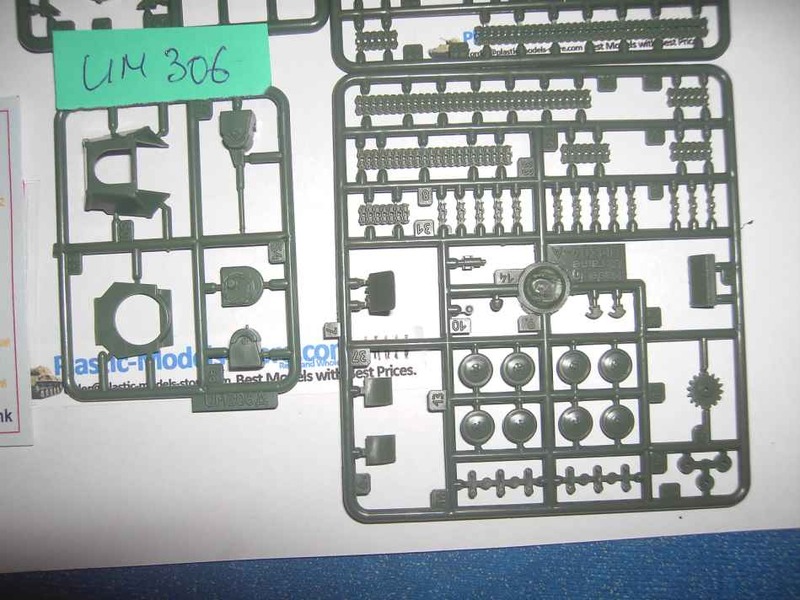 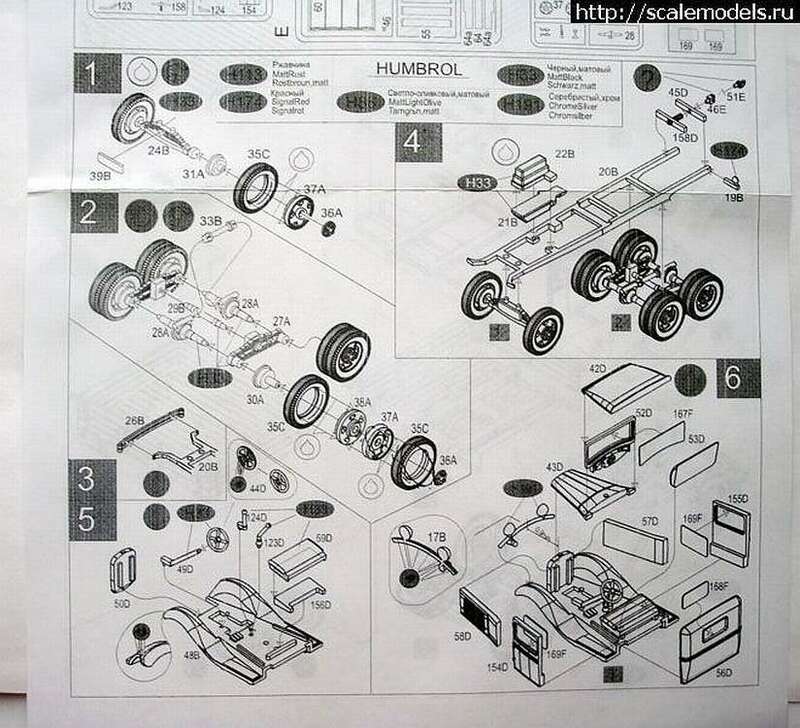 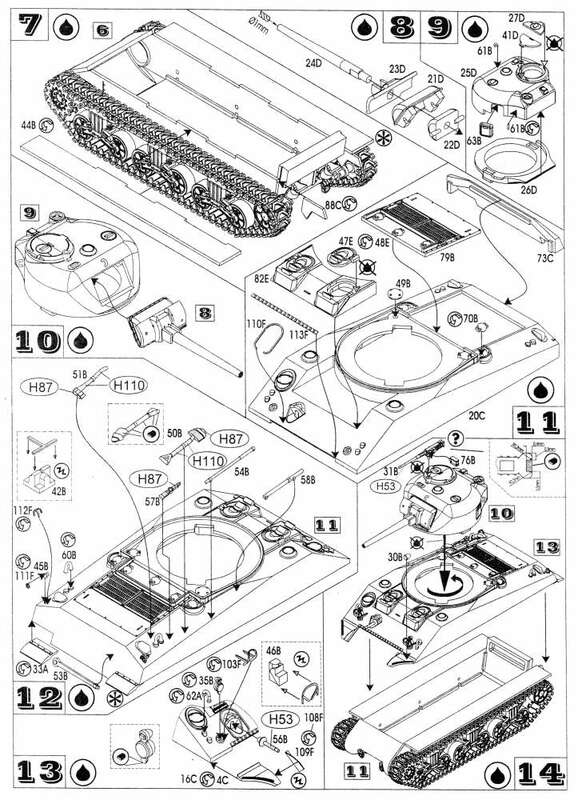 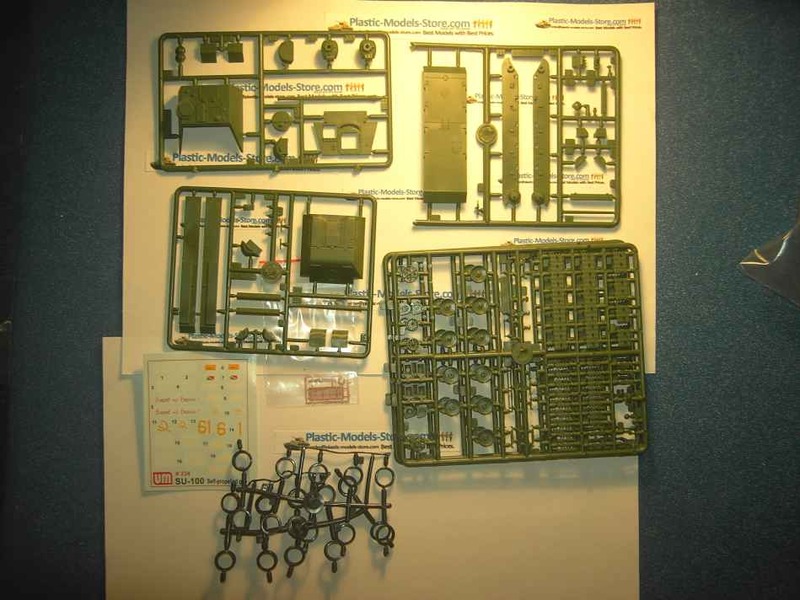 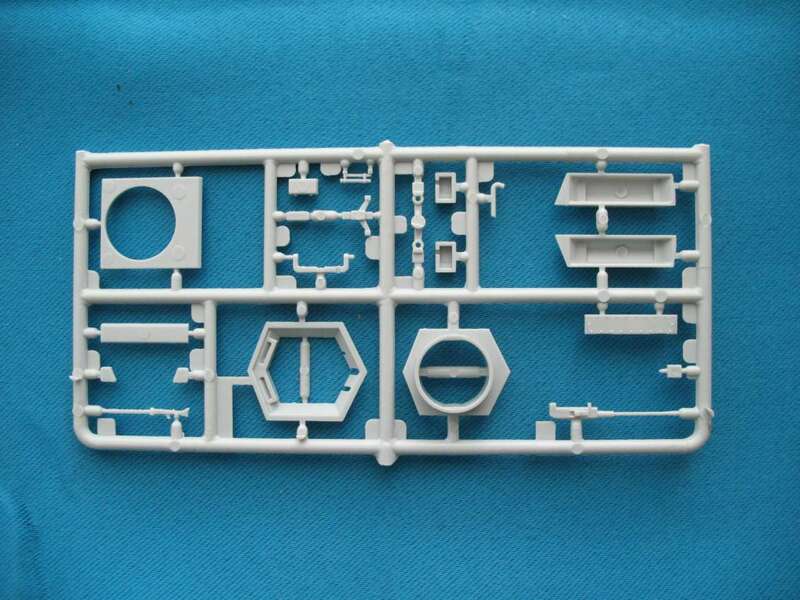 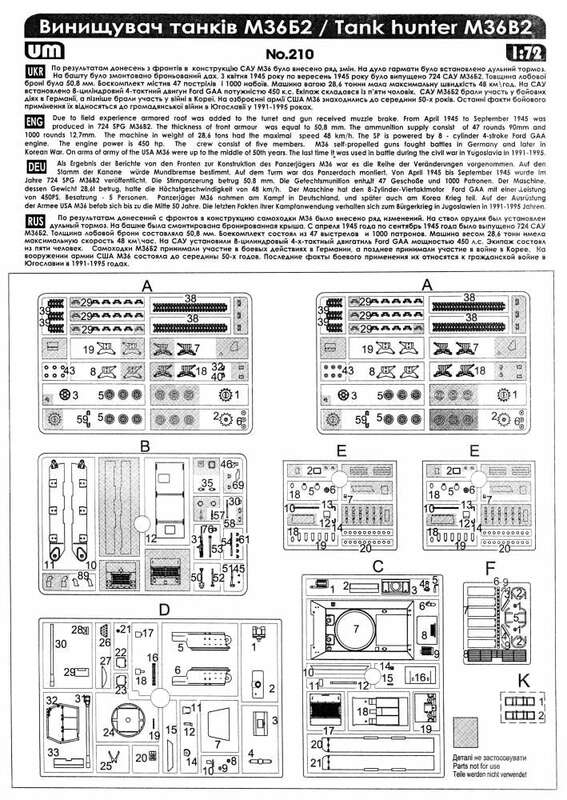 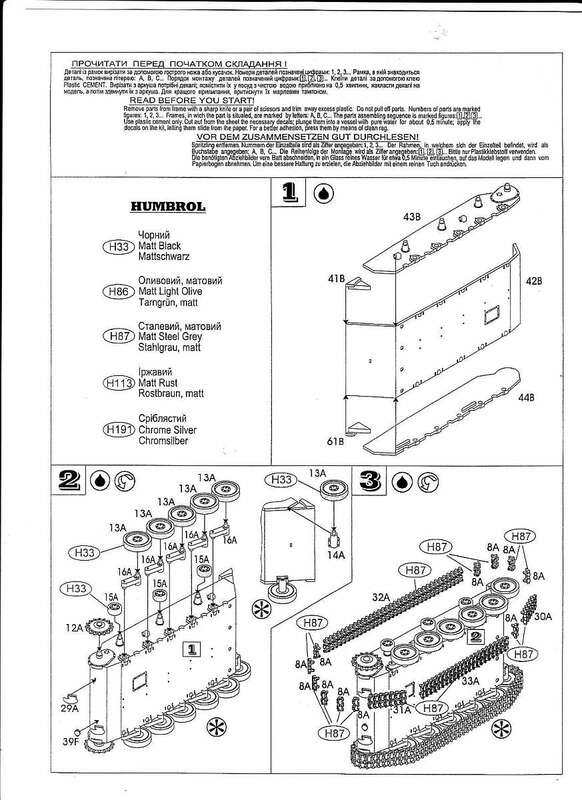 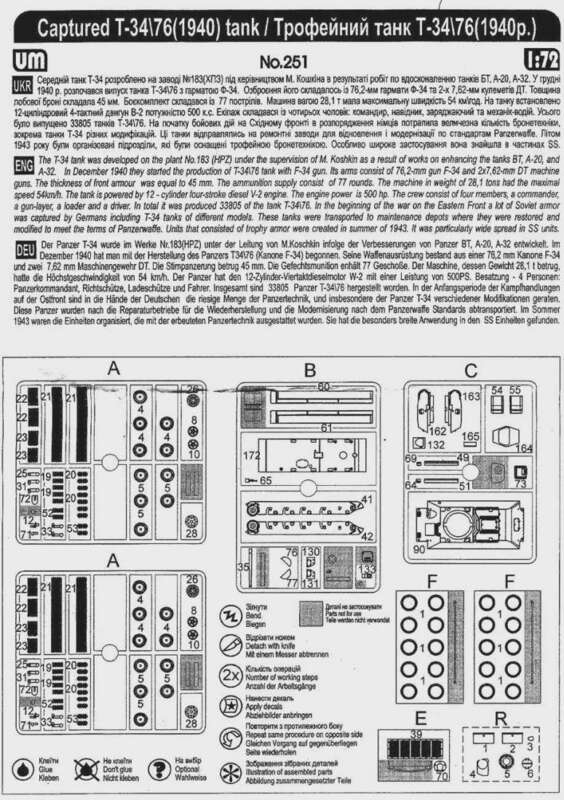 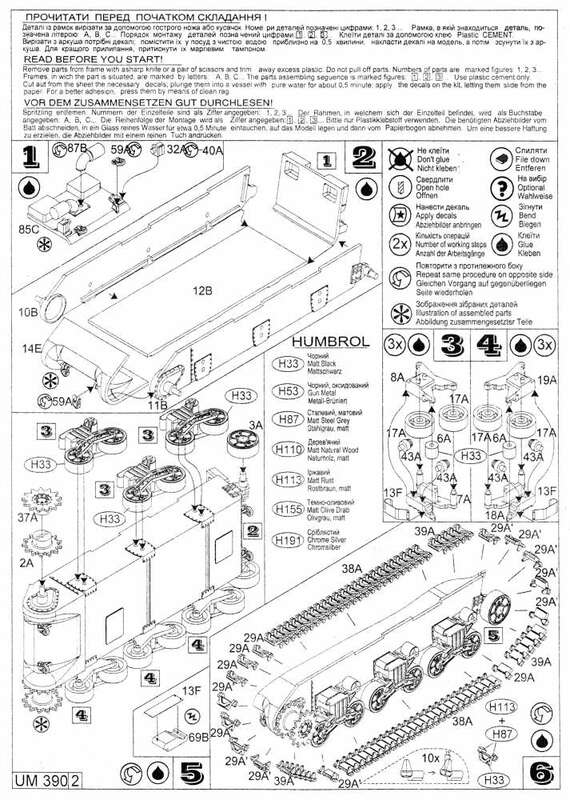 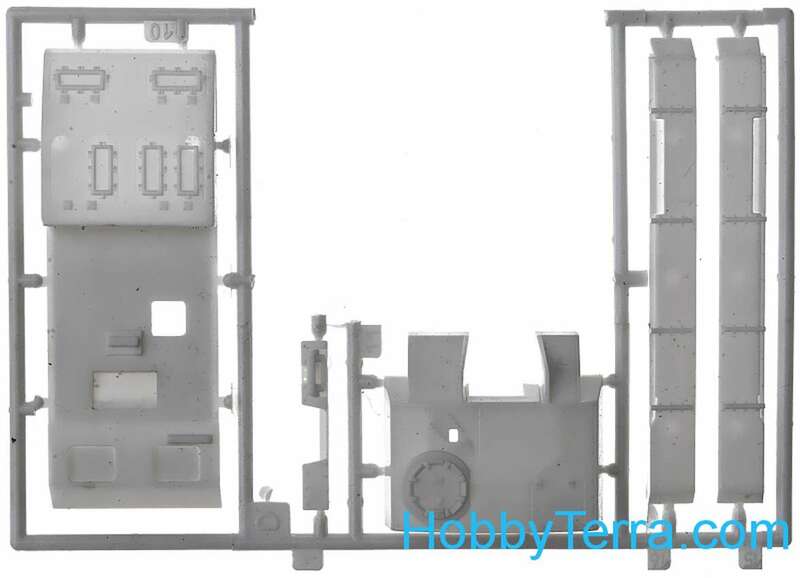 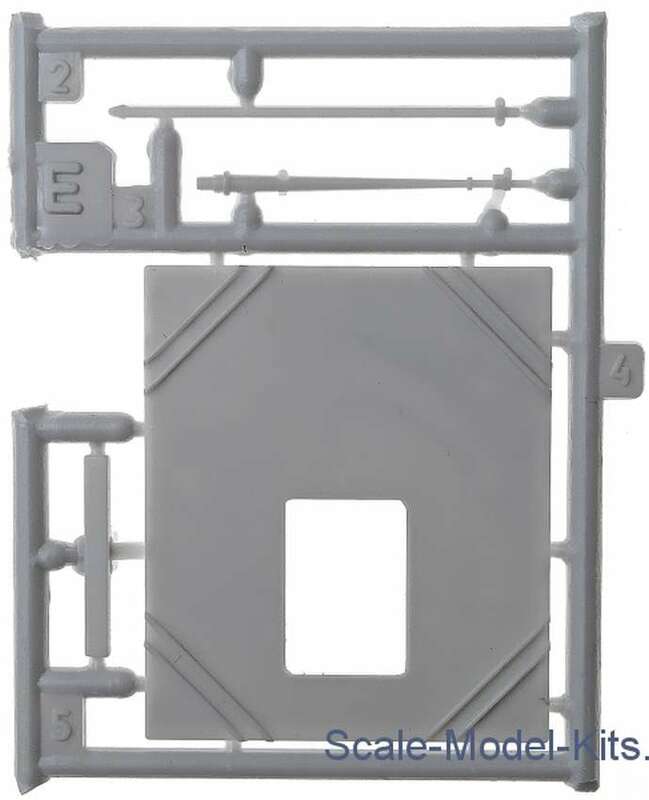 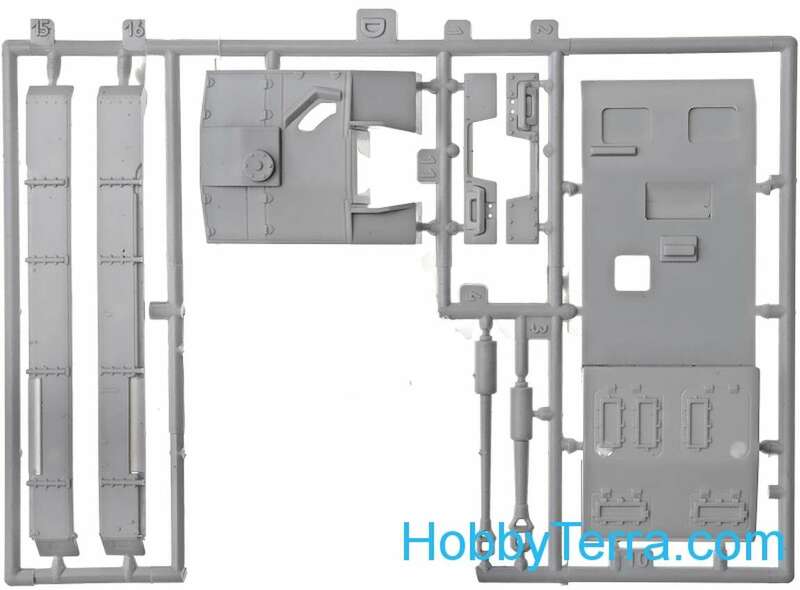 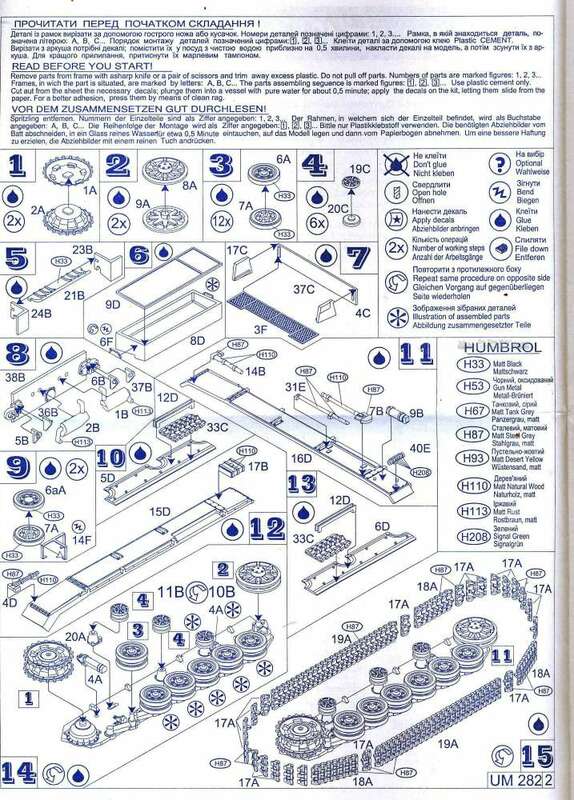 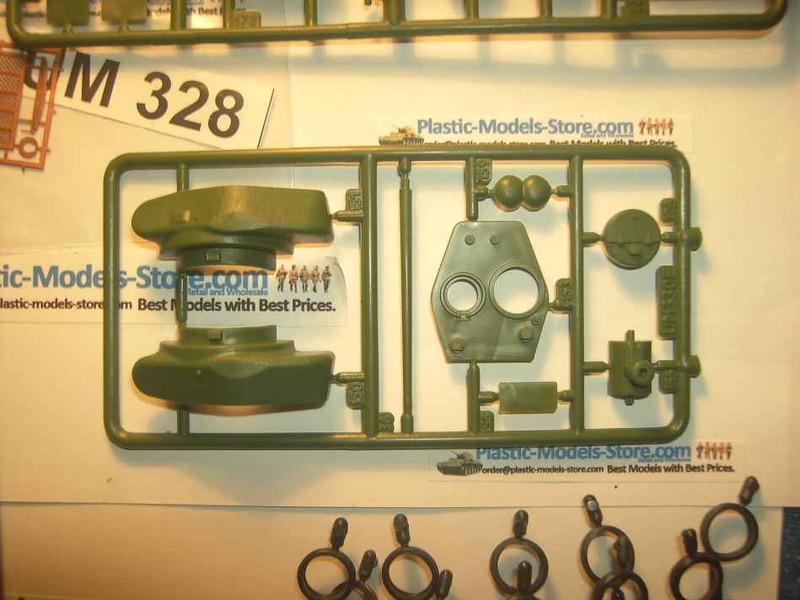 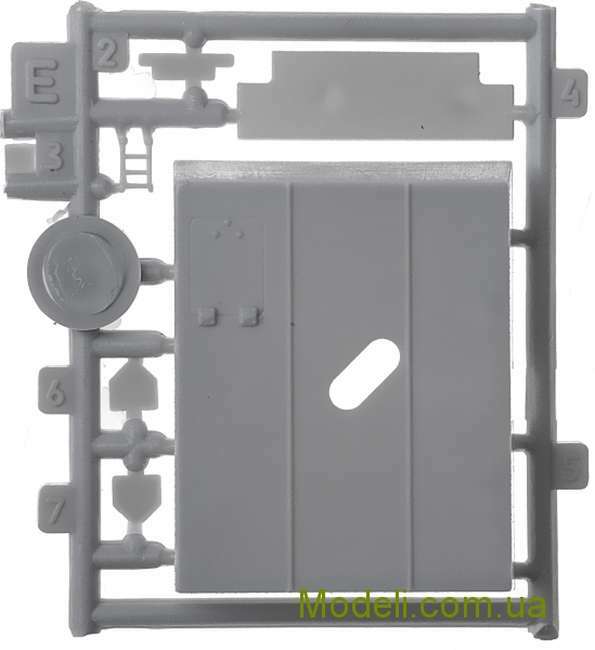 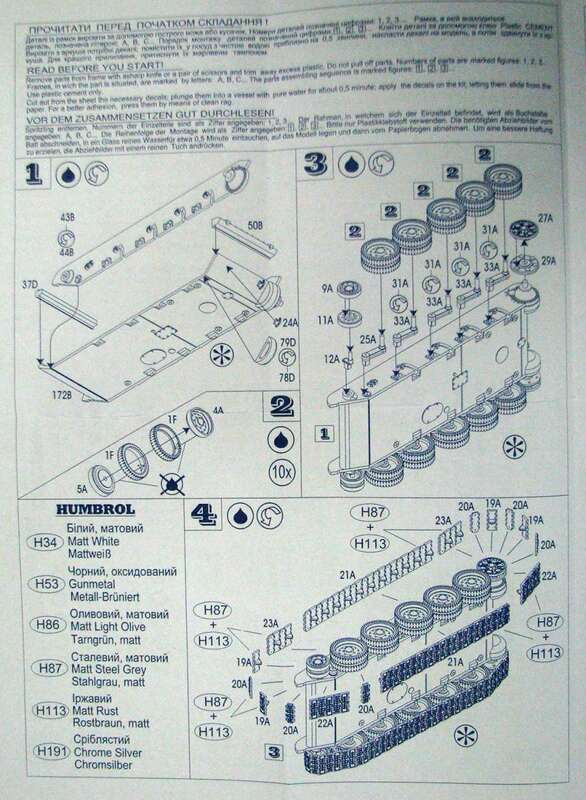 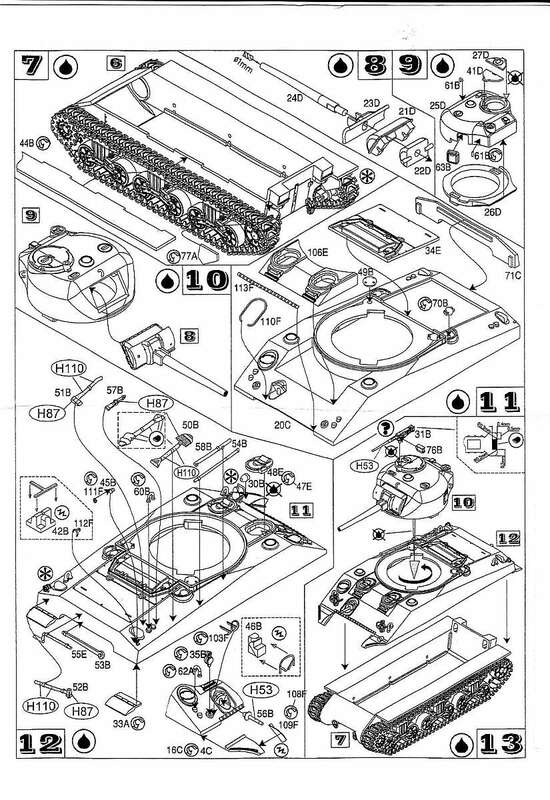 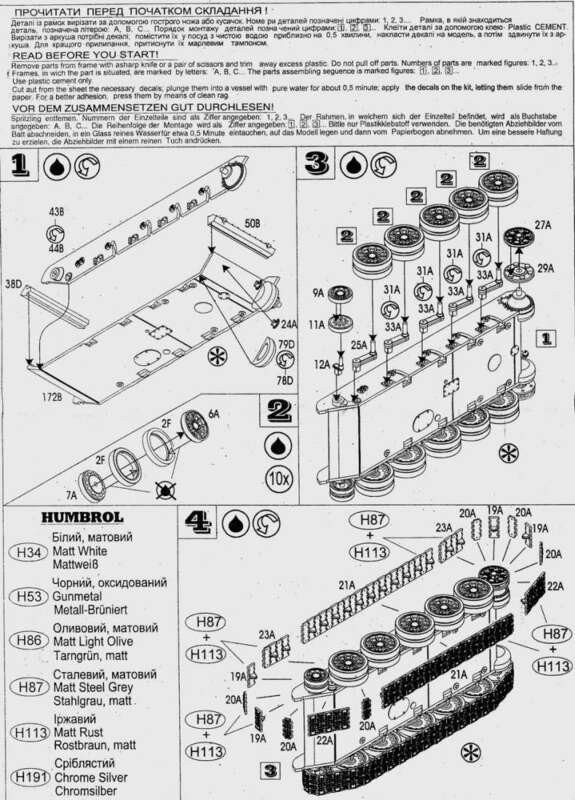 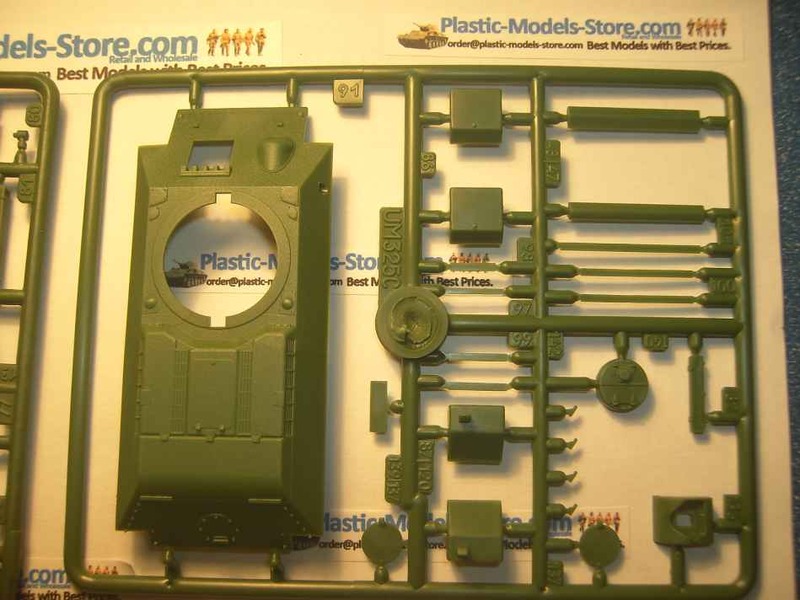 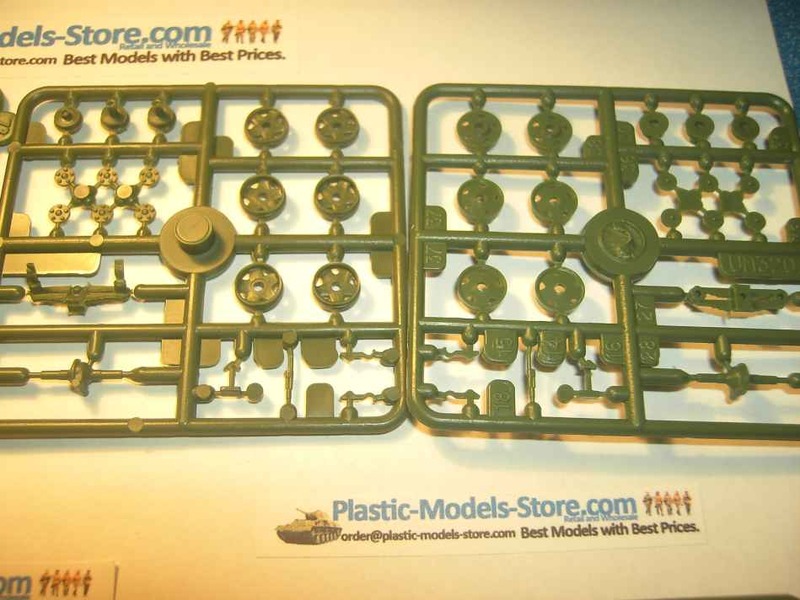 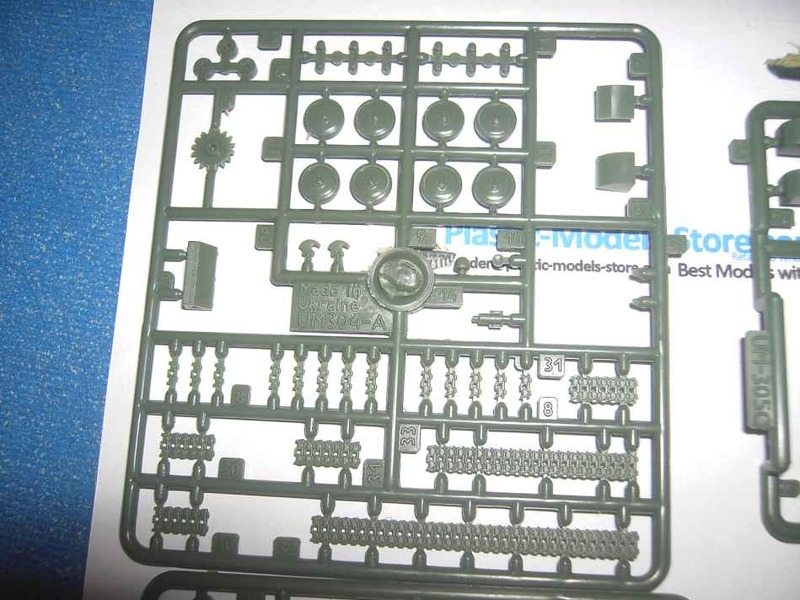 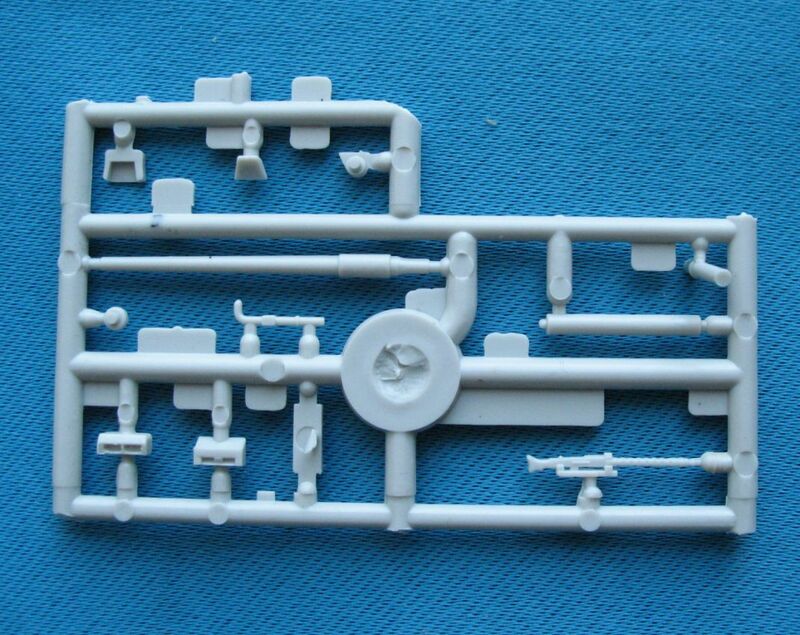 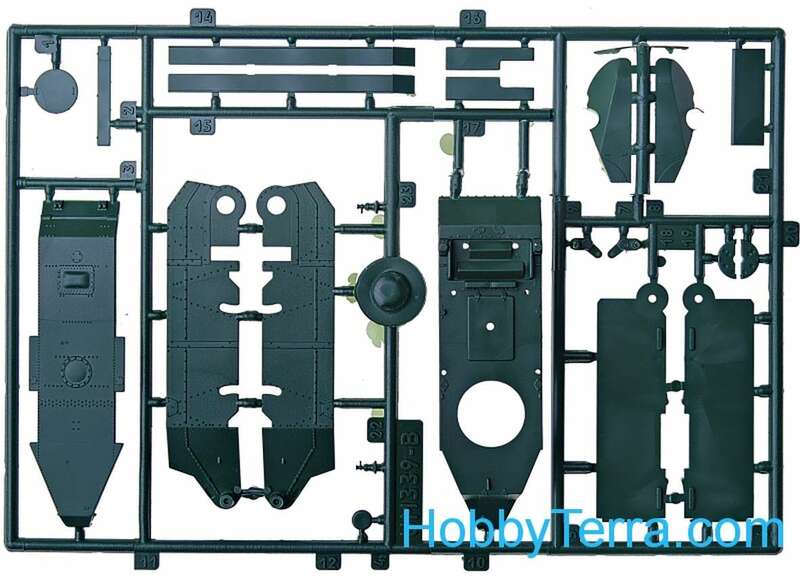 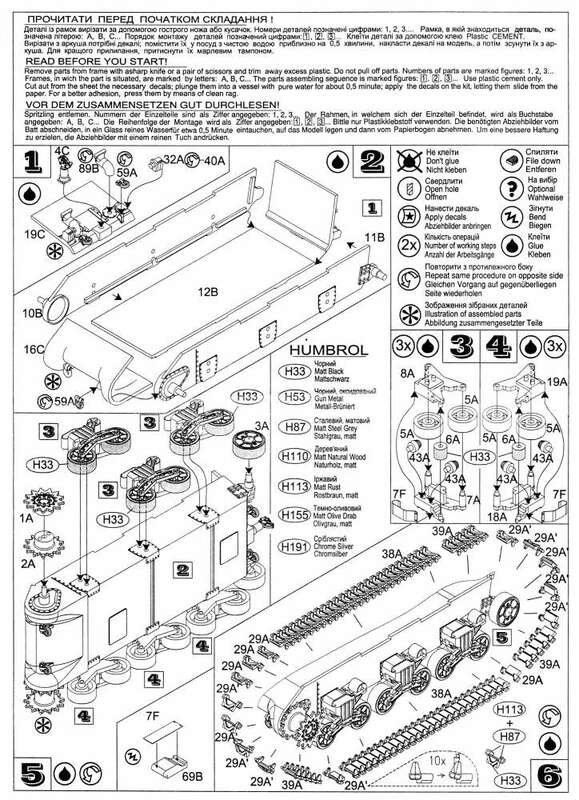 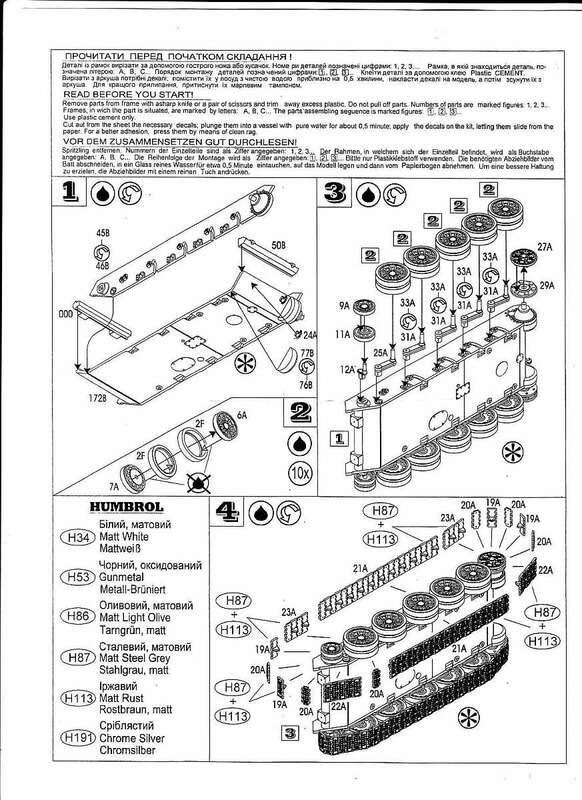 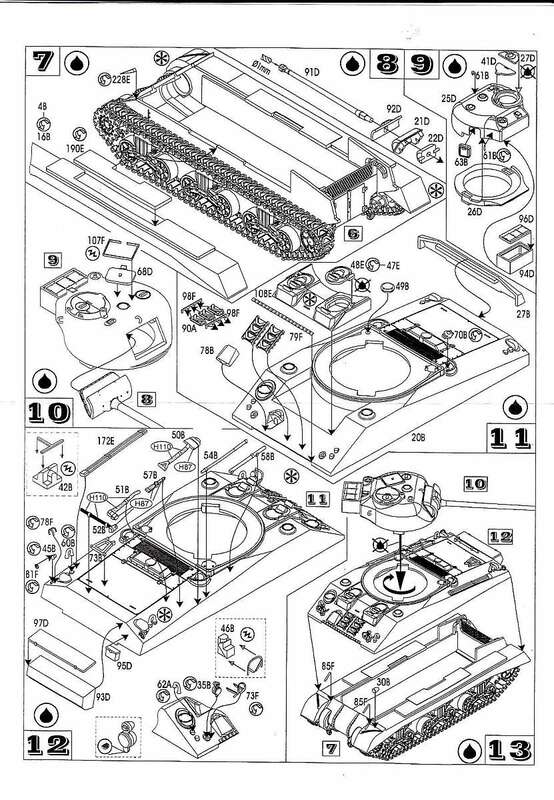 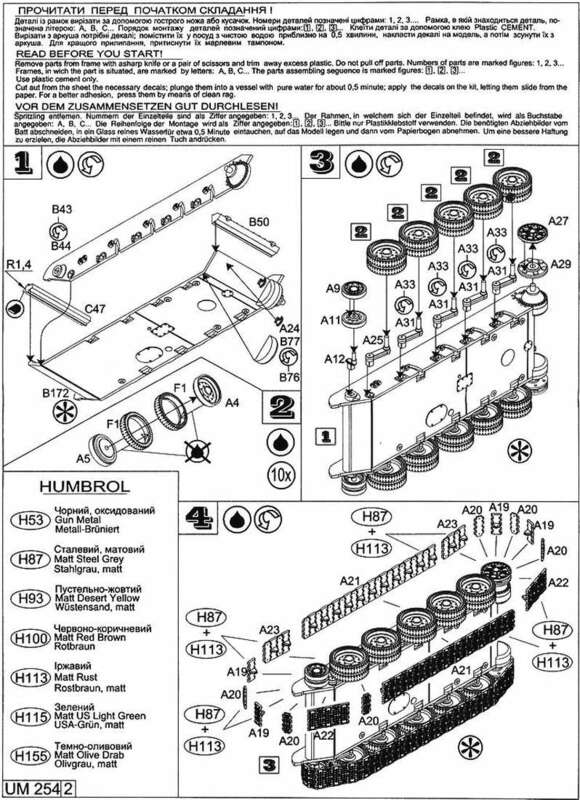 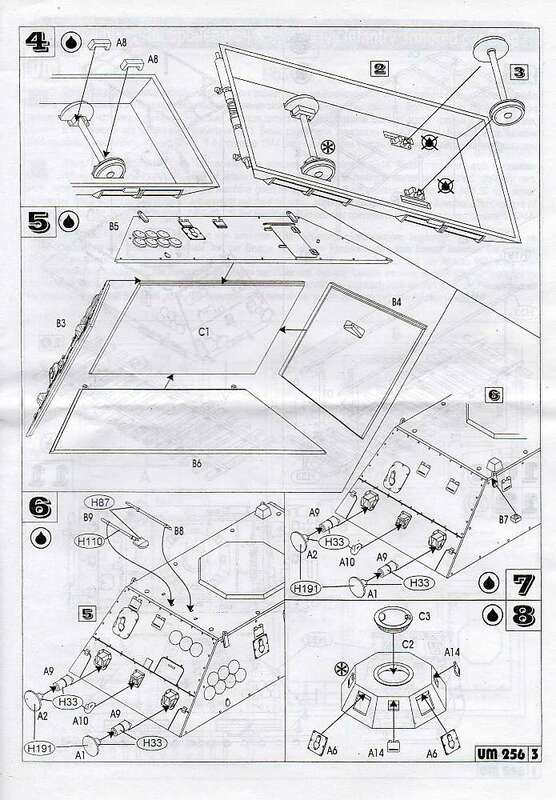 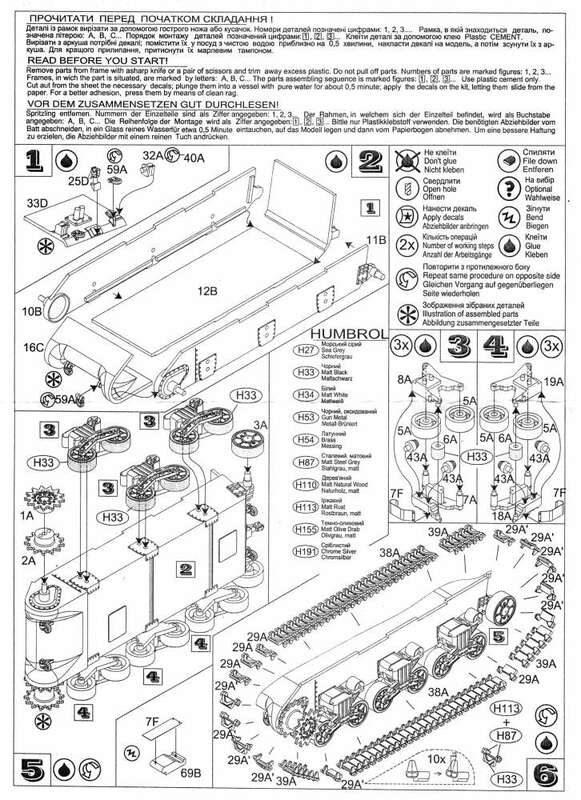 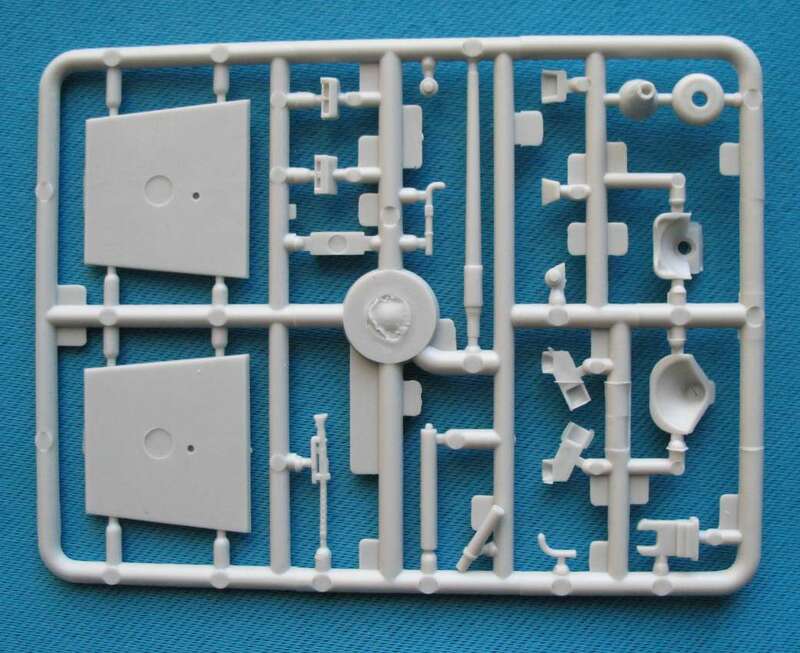 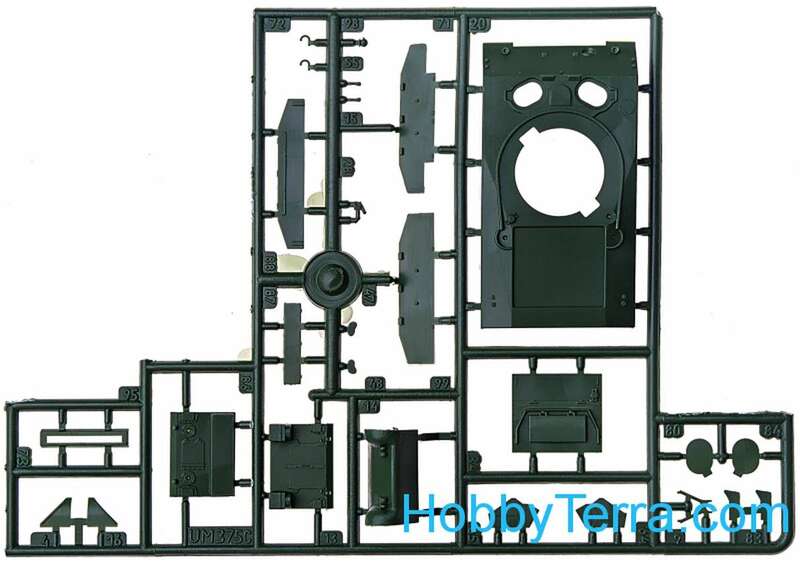 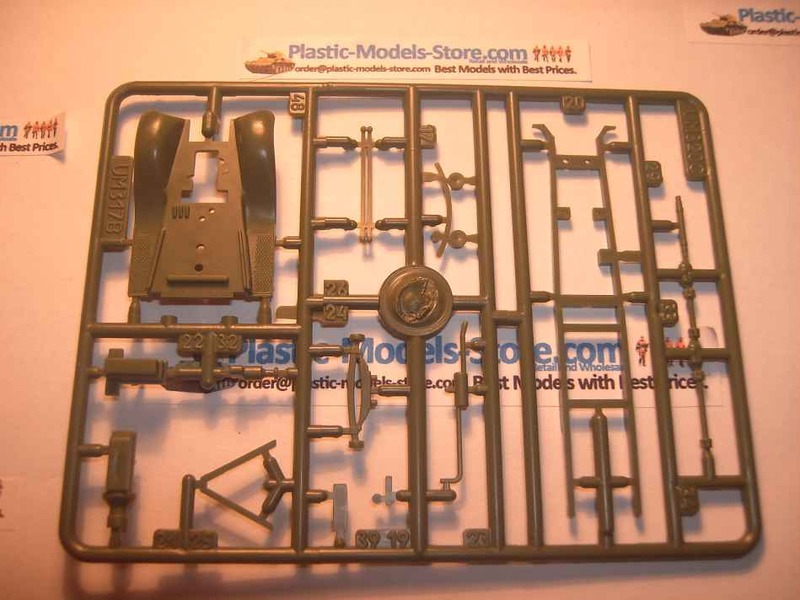 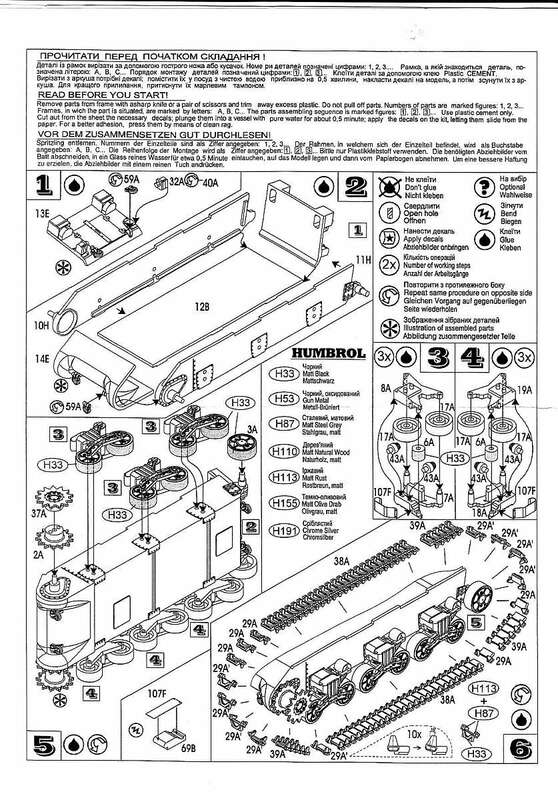 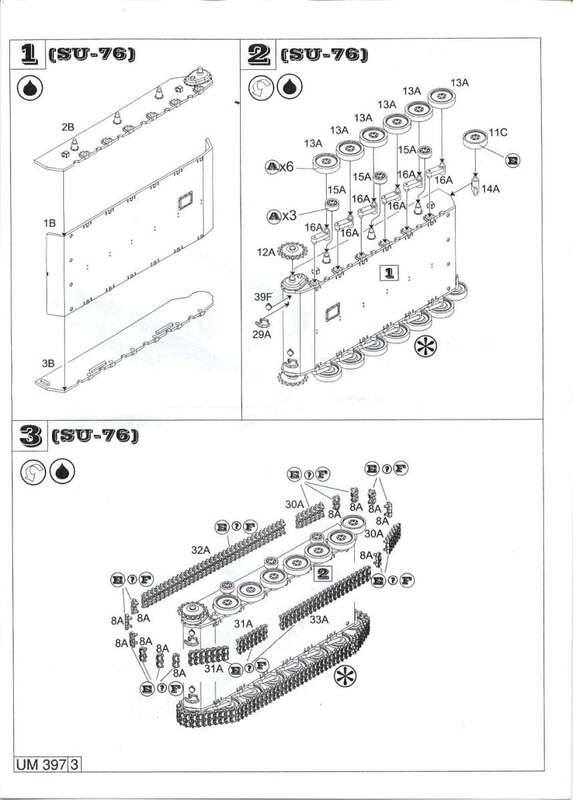 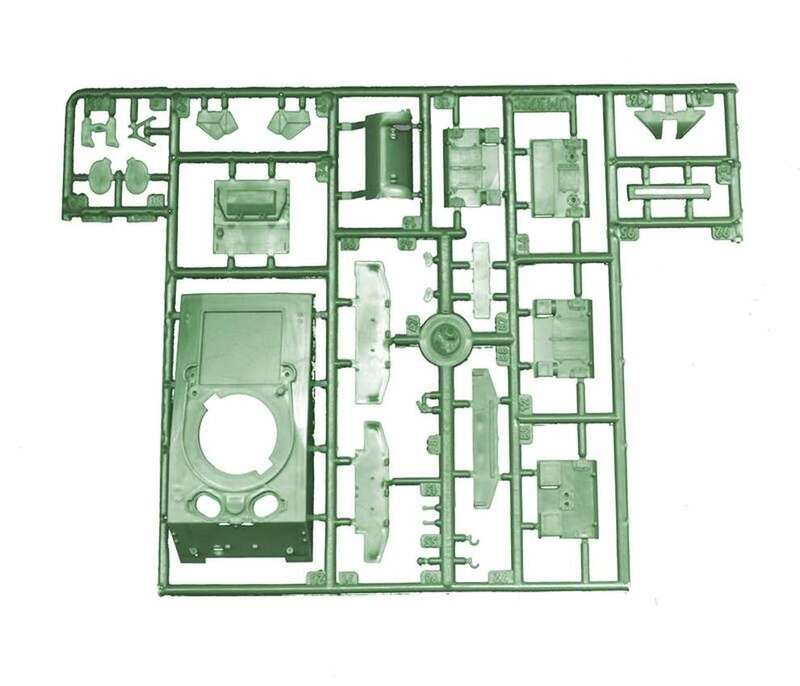 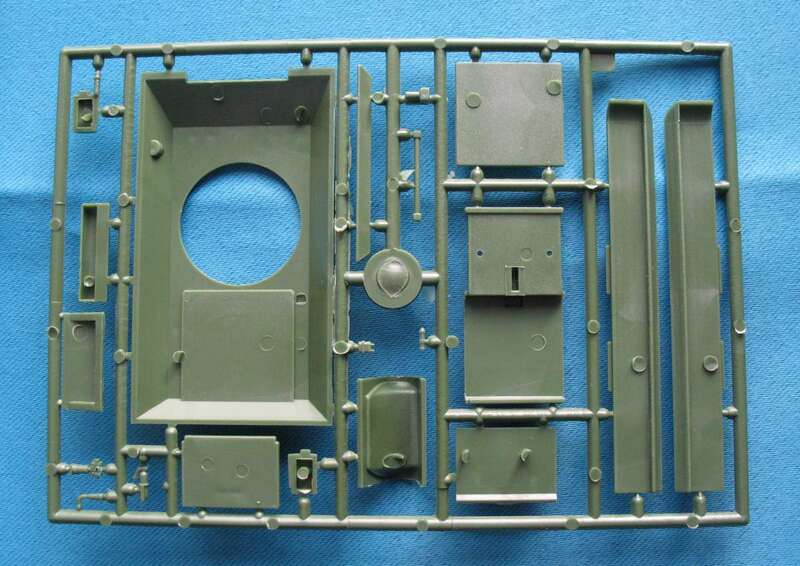 The moldings are good except for the sprue (labeled B) containing the body parts. 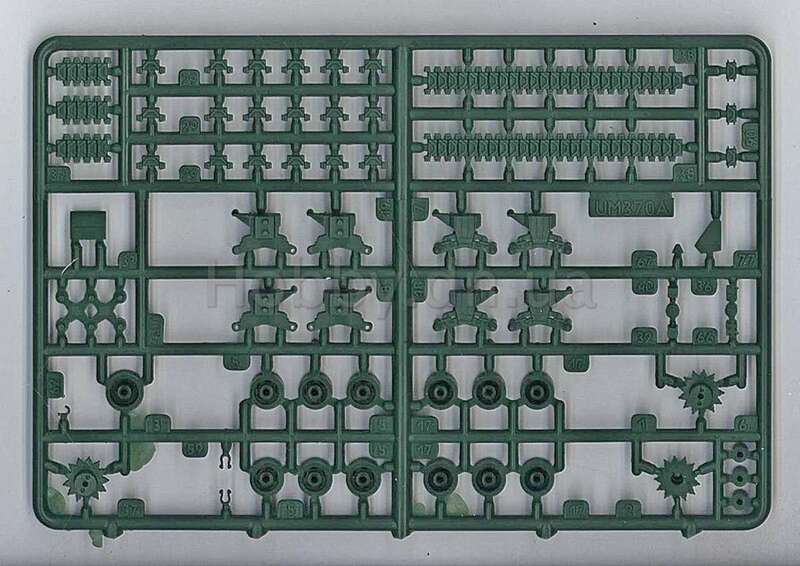 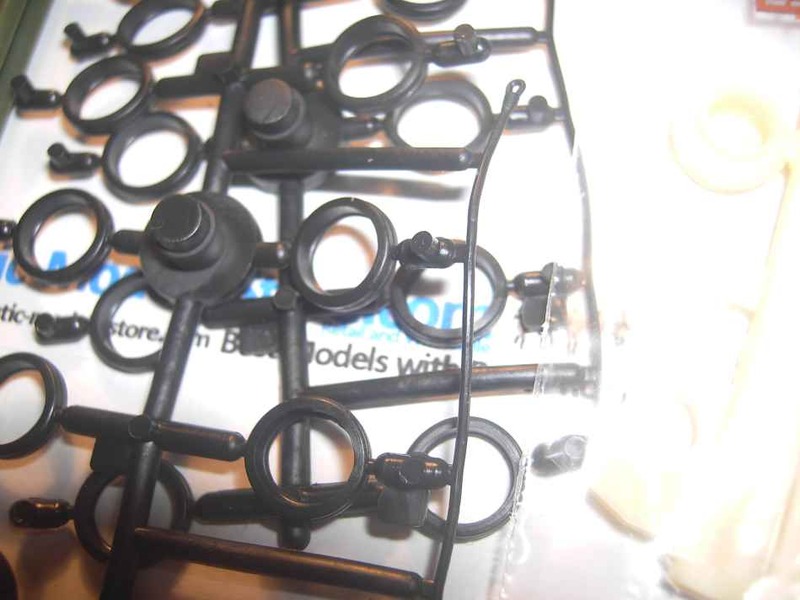 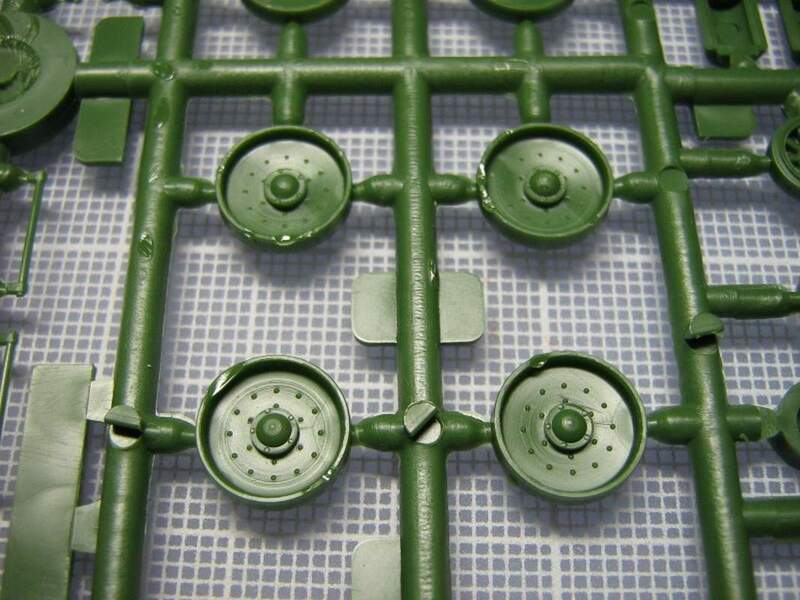 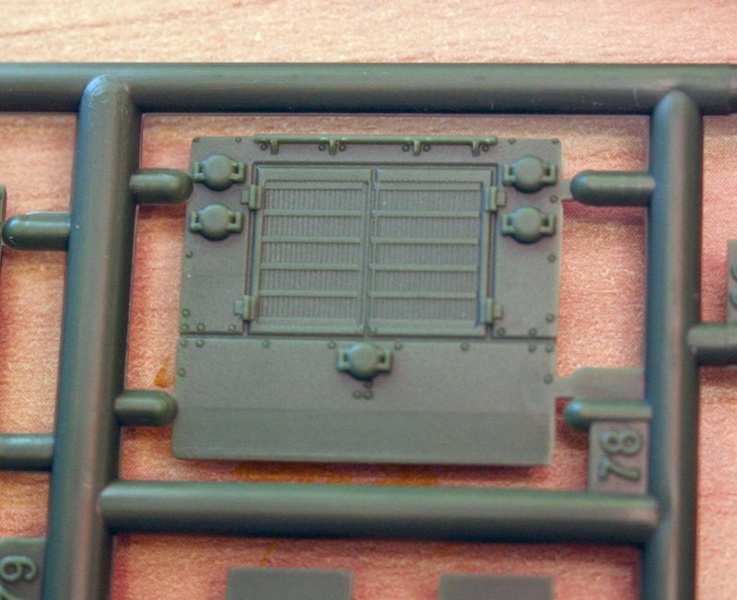 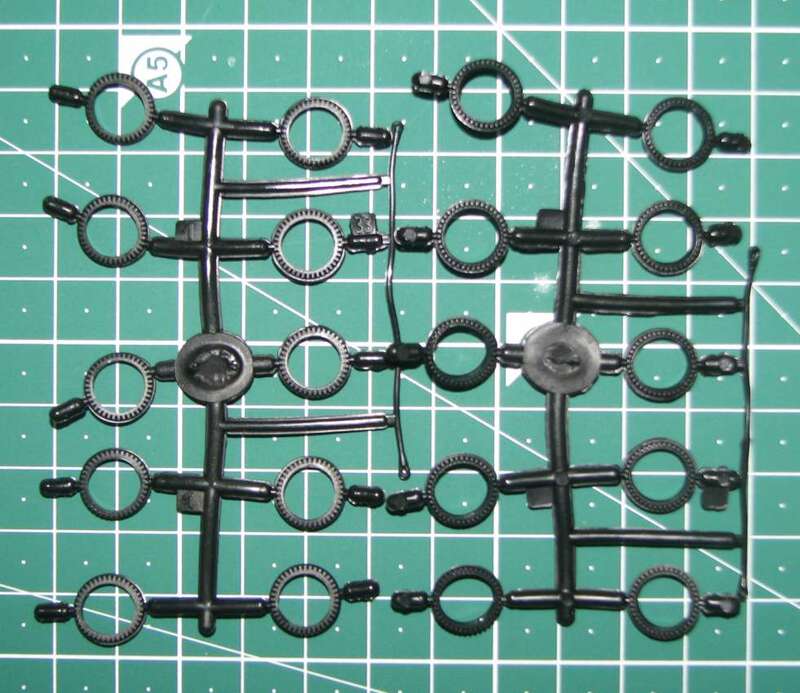 They all have fine striations/flow lines all over the plastic parts and in the most inconvenient of spots - such as where the rivets are located. 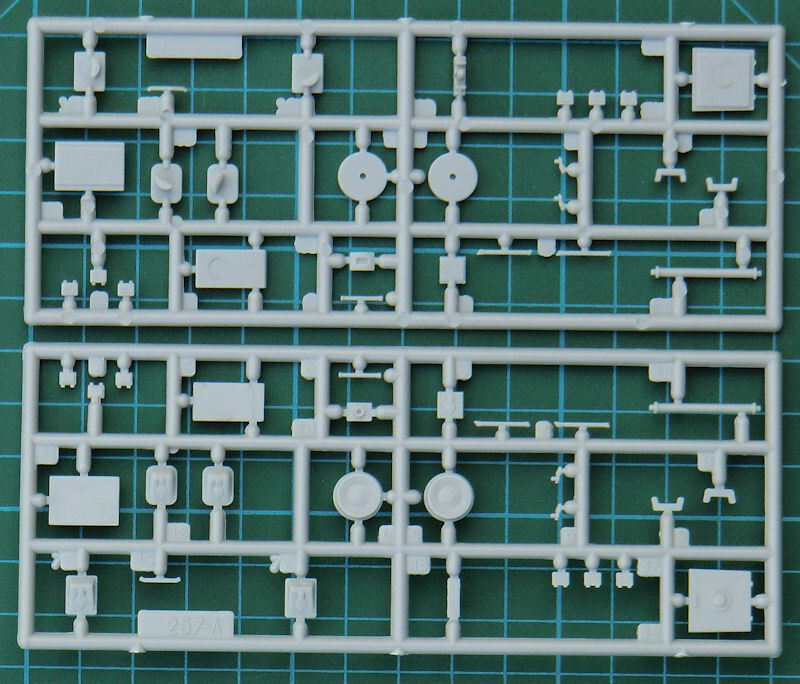 To fill the striations means you'll most likely also wipe out the adjacent detail. 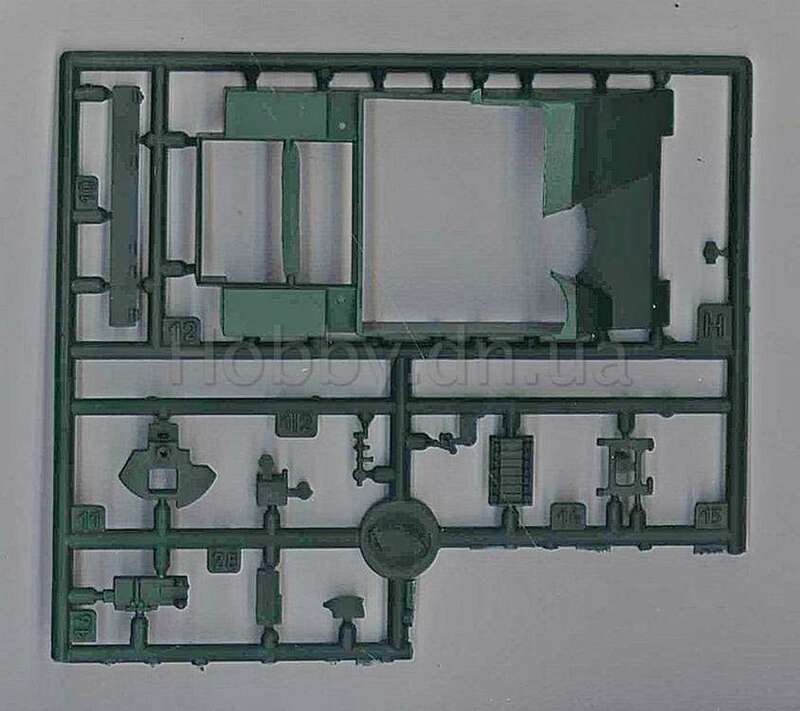 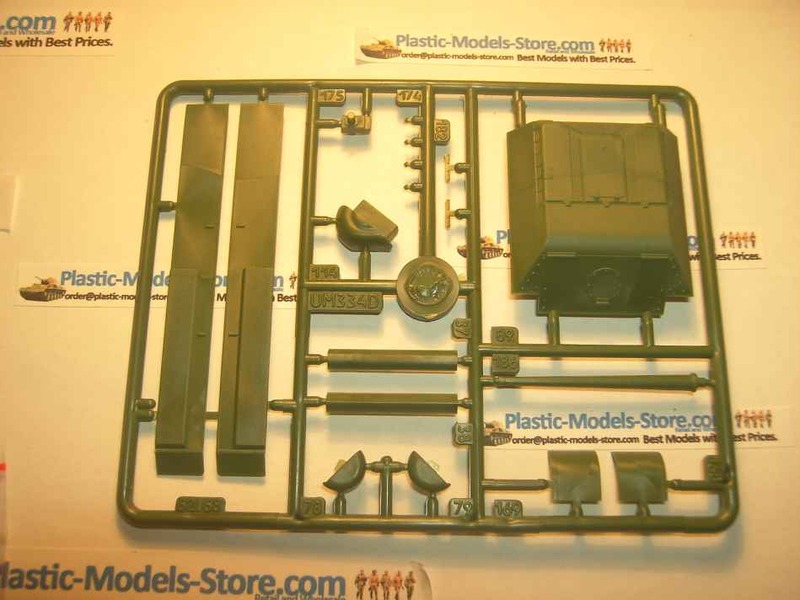 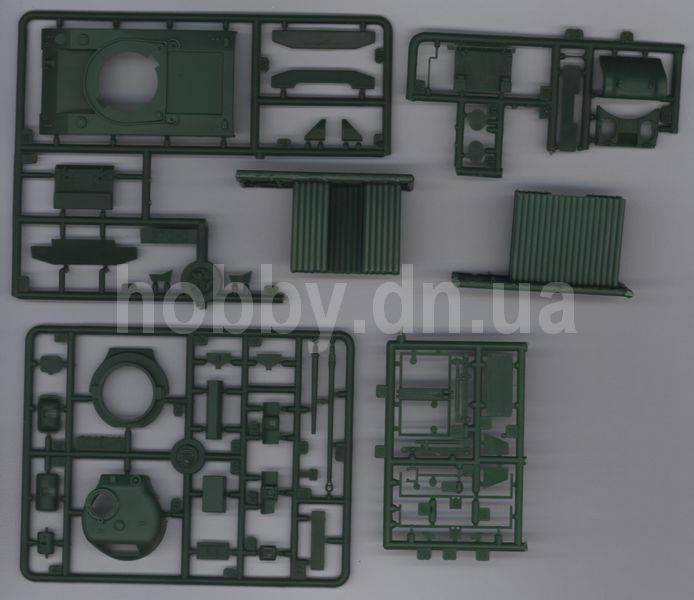 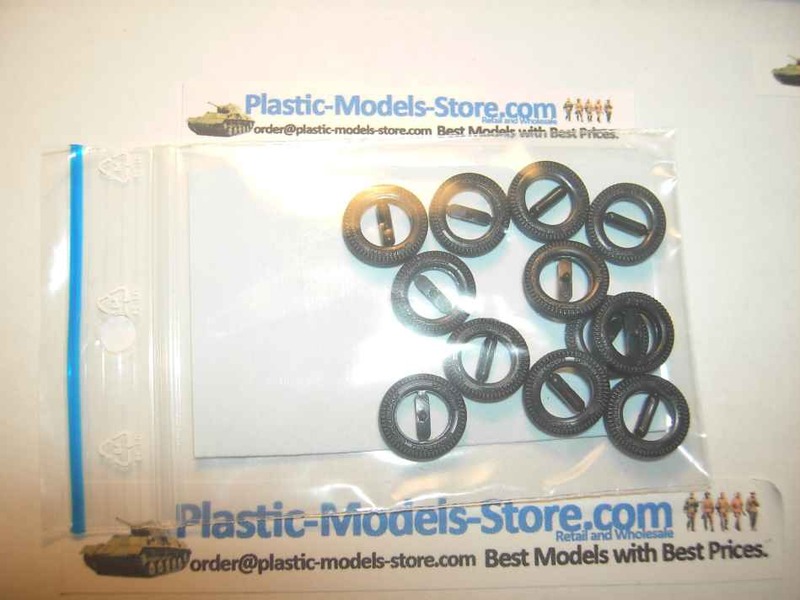 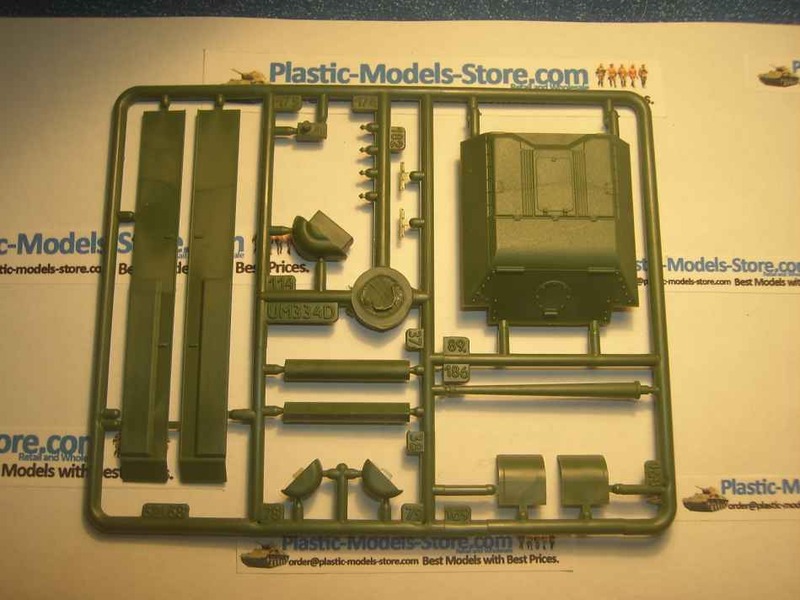 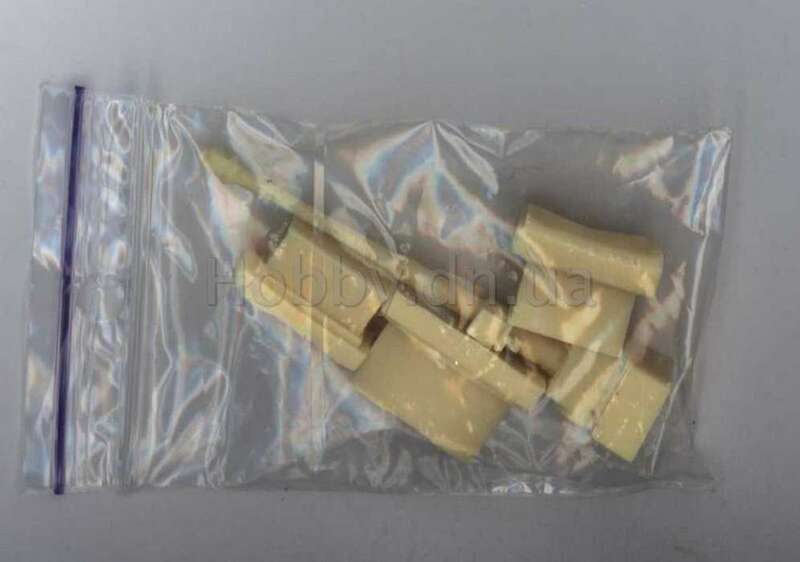 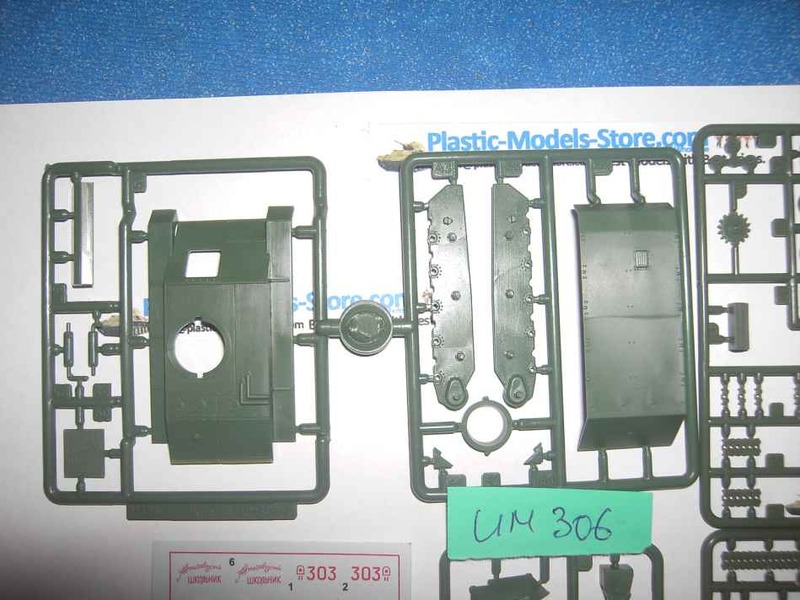 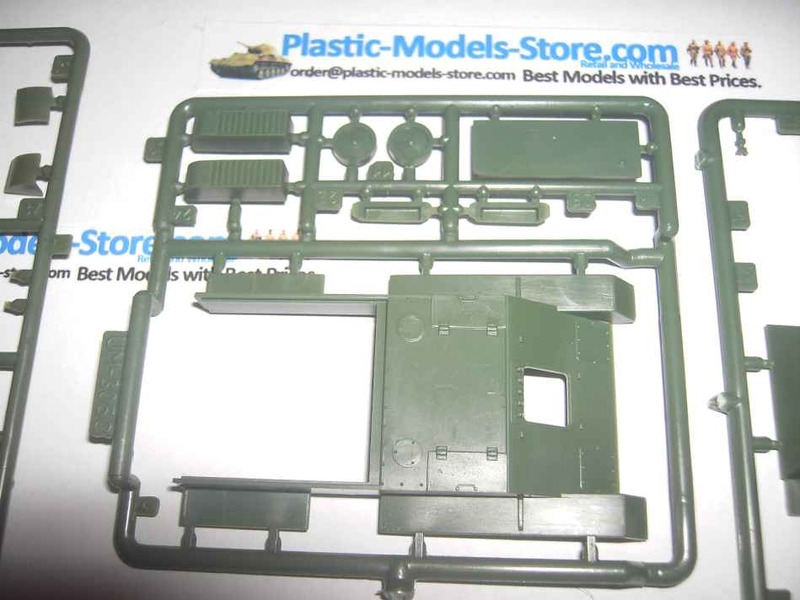 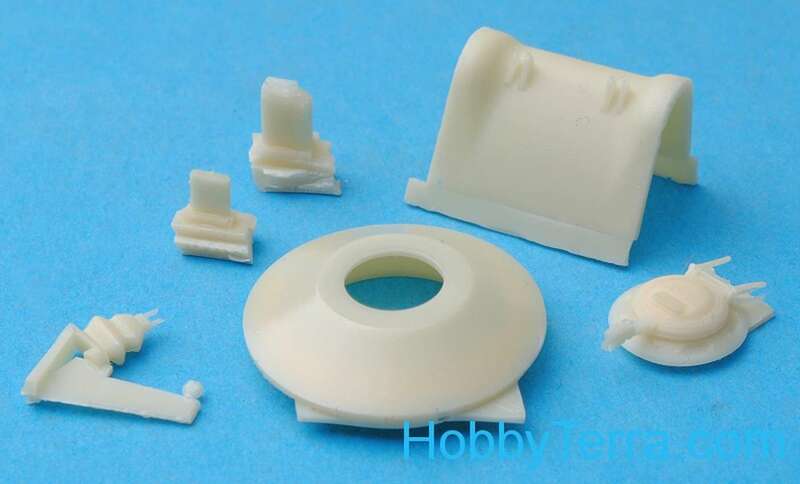 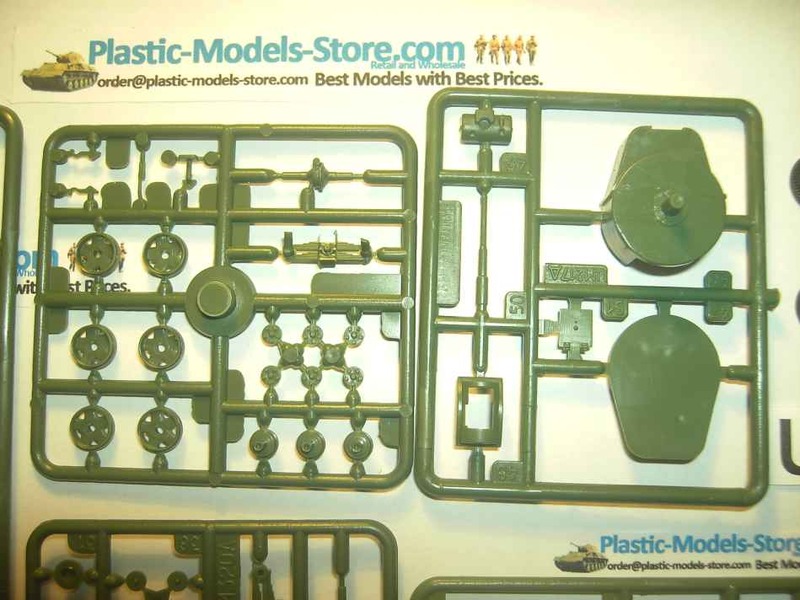 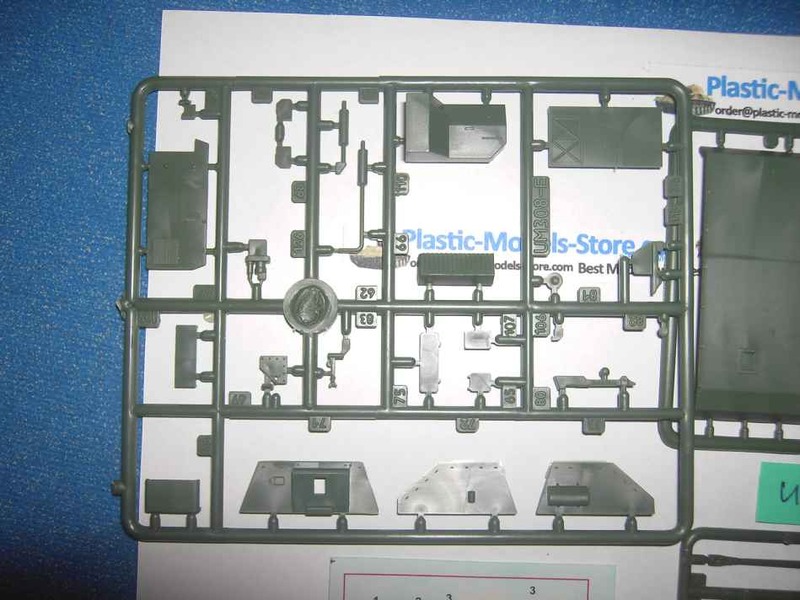 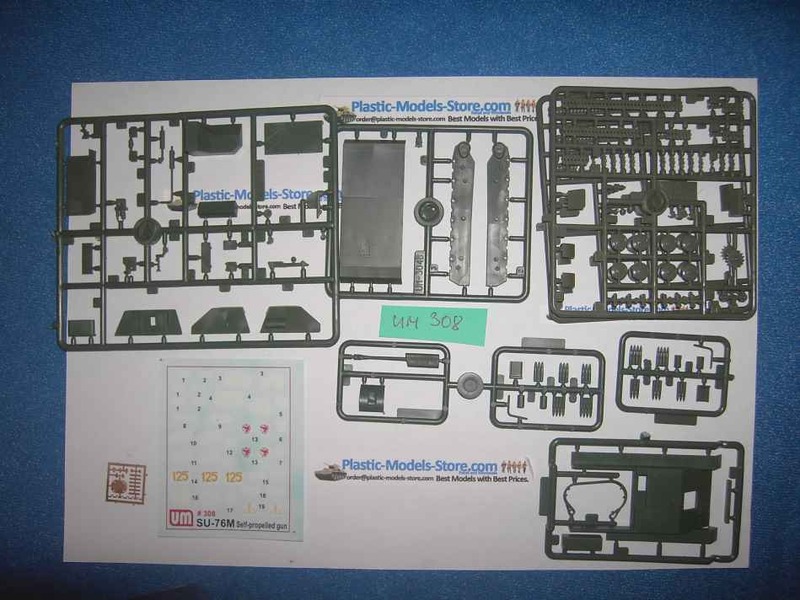 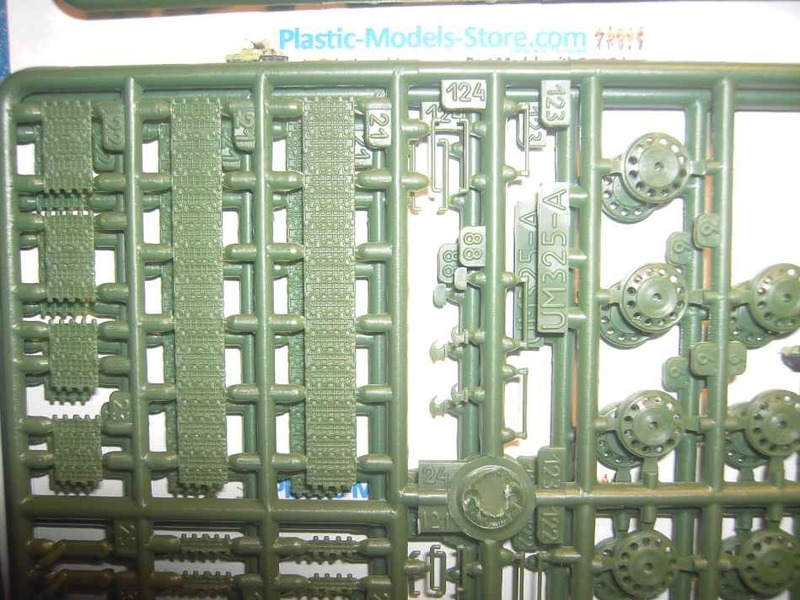 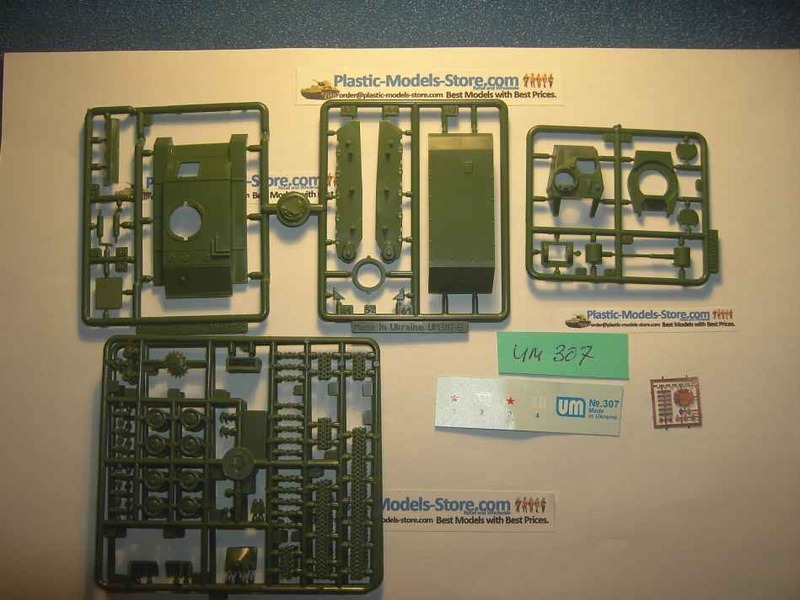 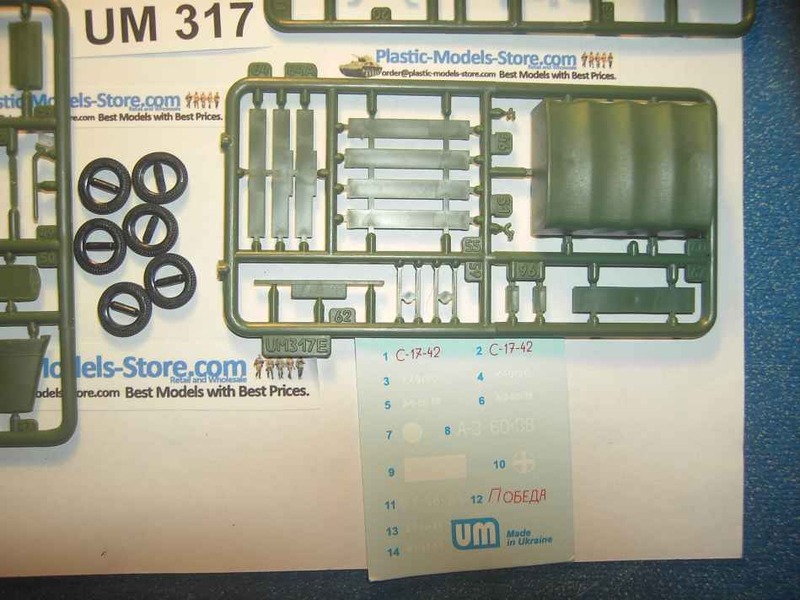 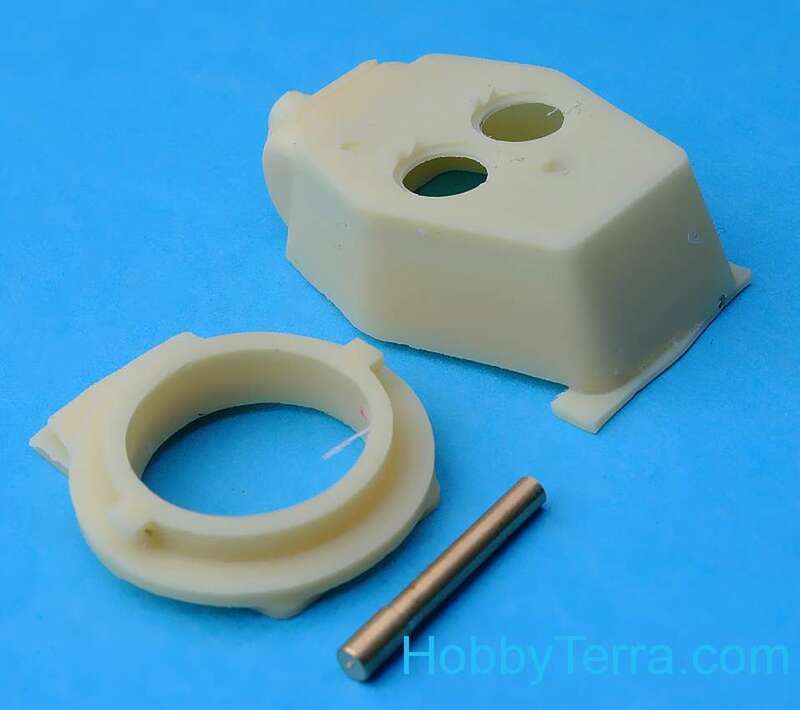 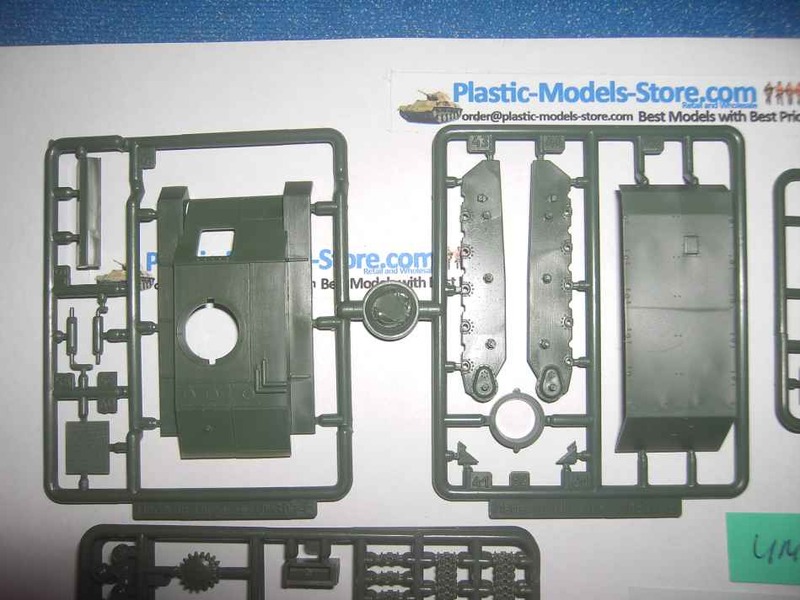 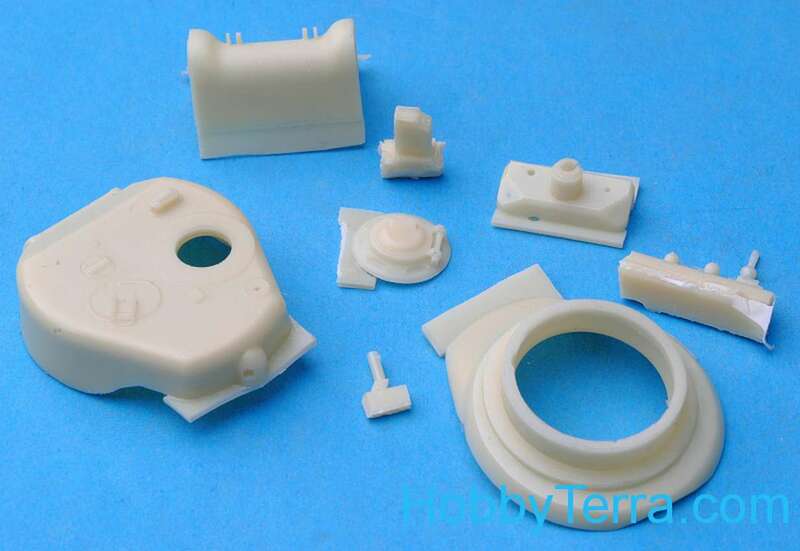 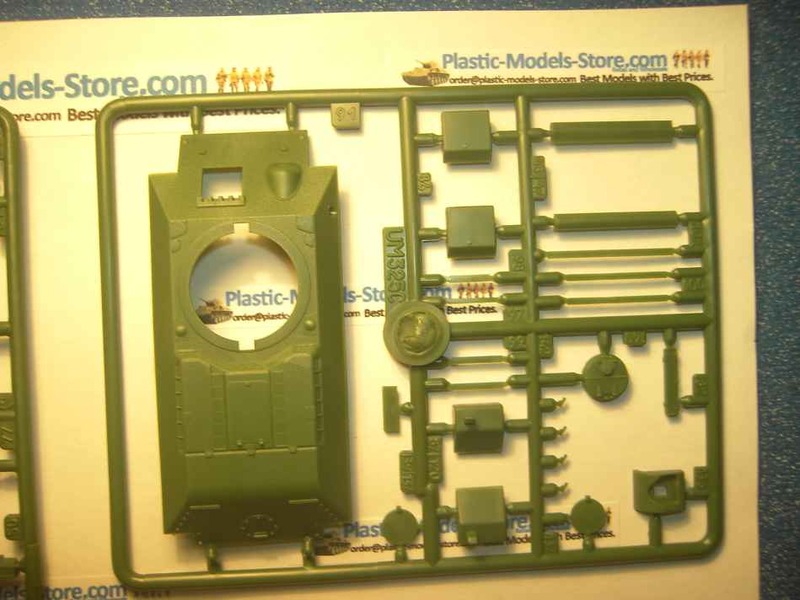 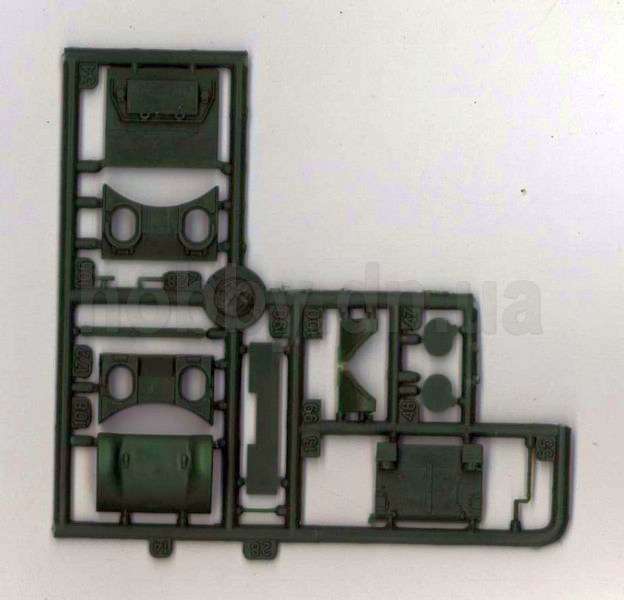 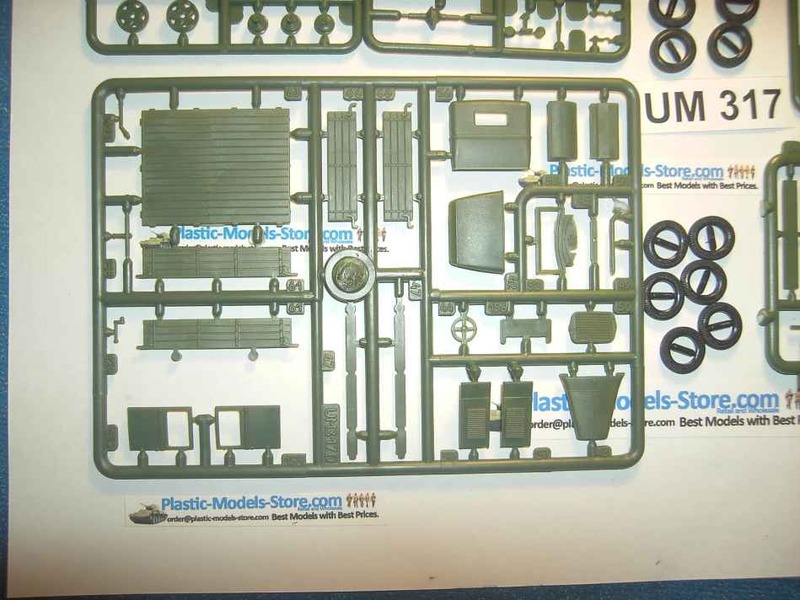 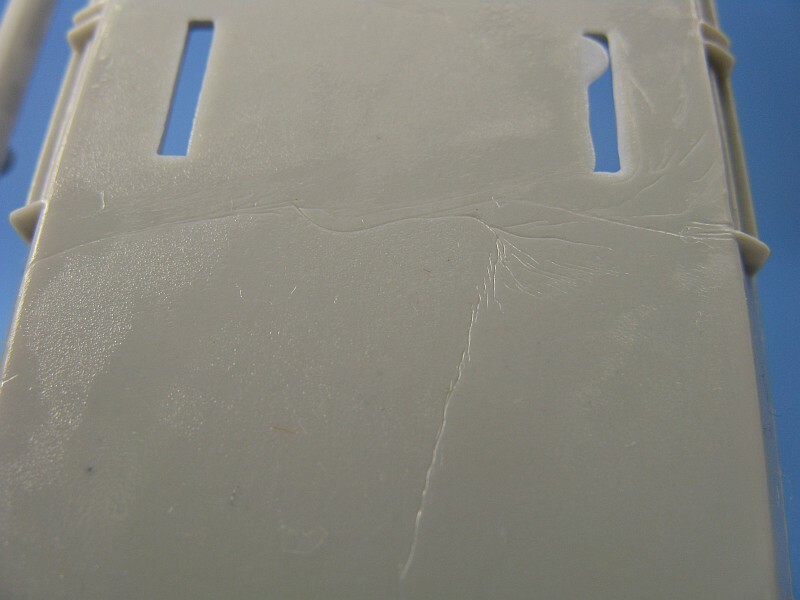 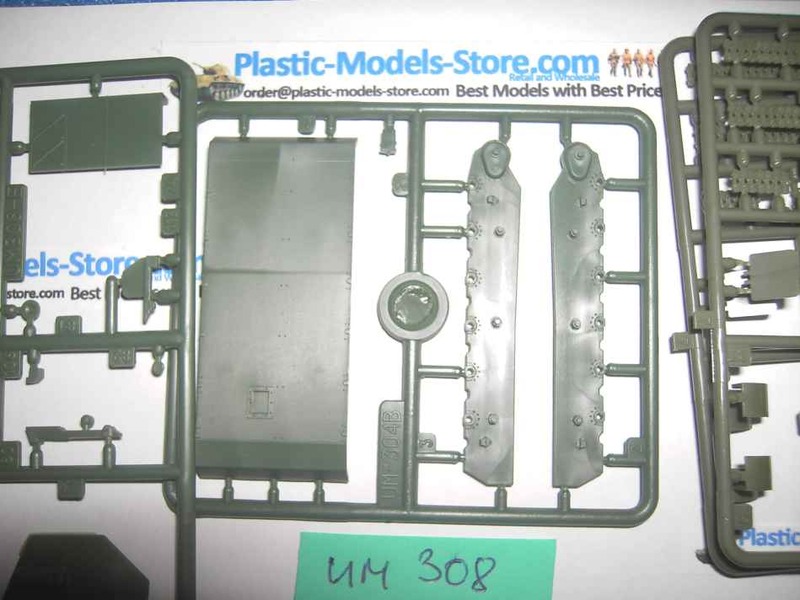 To me it seems that the mold release agent (which covers the parts in a thick greasy coat) is the culprit and prevented the plastic from flowing into the mold properly. 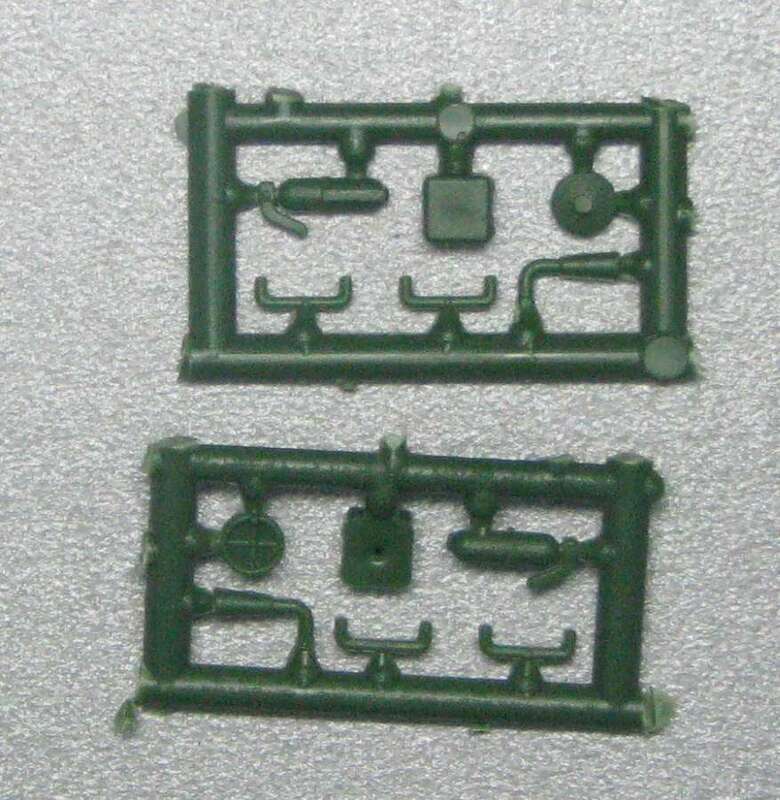 And the vent like structures on the lower body pan are terrible. 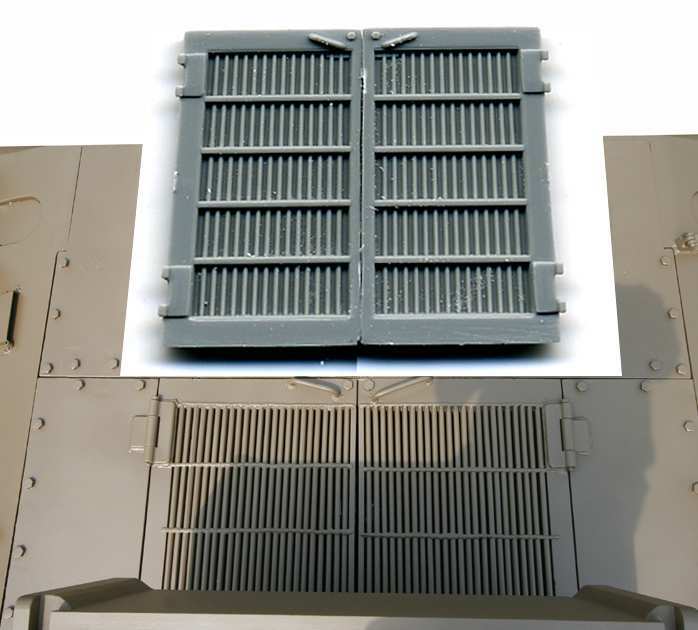 The triangular shaped gussets (or whatever they're called) that sit beside the vents are poorly cast, resulting in large parts of them missing. 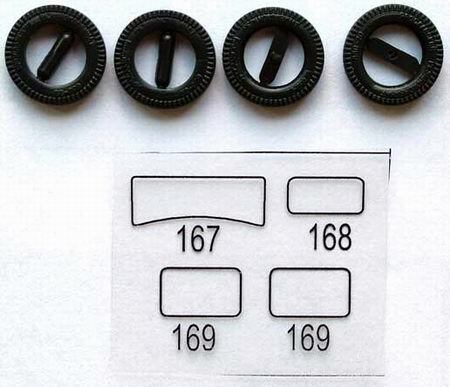 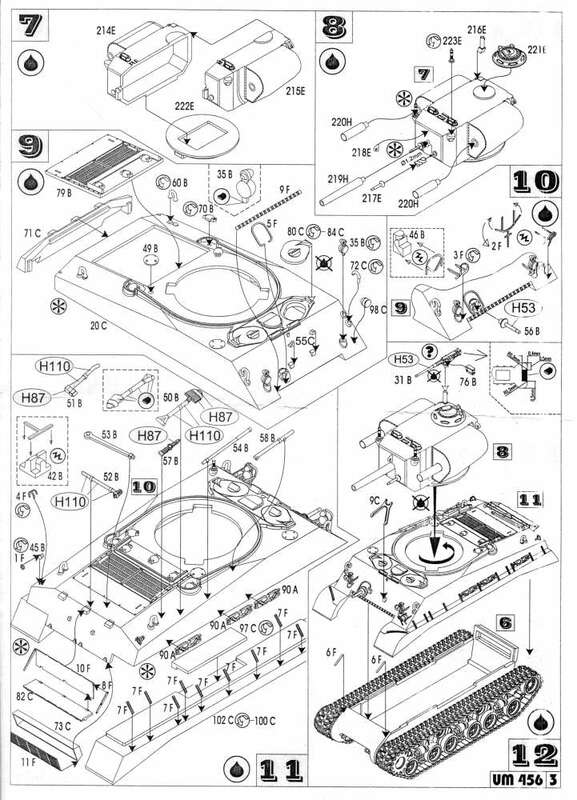 Fixing these would be next to impossible. 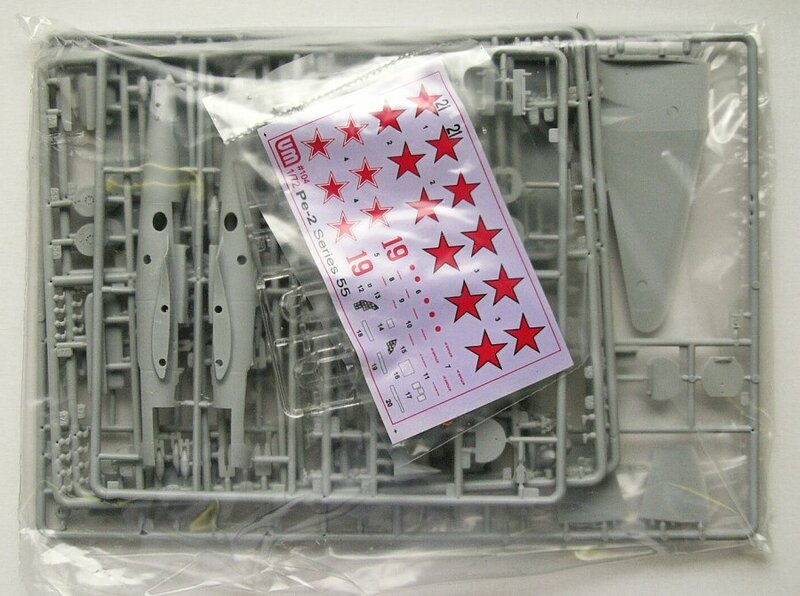 This really irks me since I was expecting this kit to be light years ahead of Attack's resin version I built earlier this year. 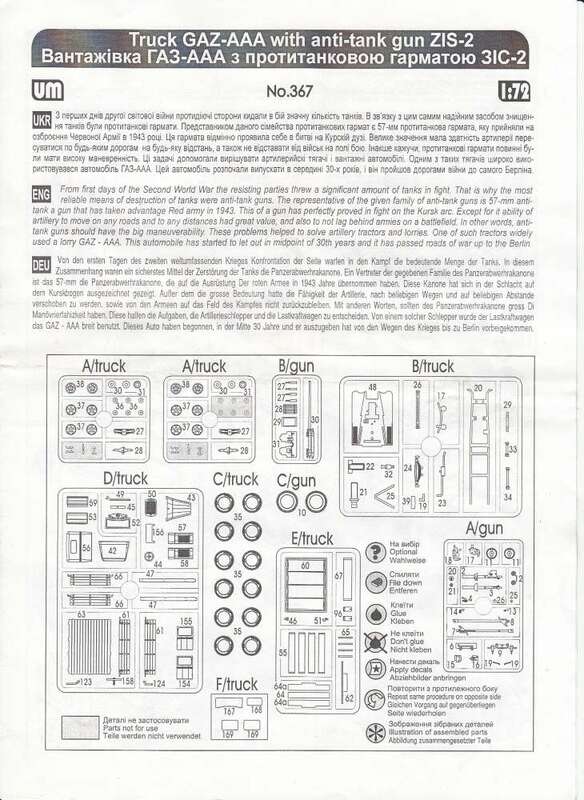 I felt the Attack kit was poor but this one gives it a good run at being even worse. 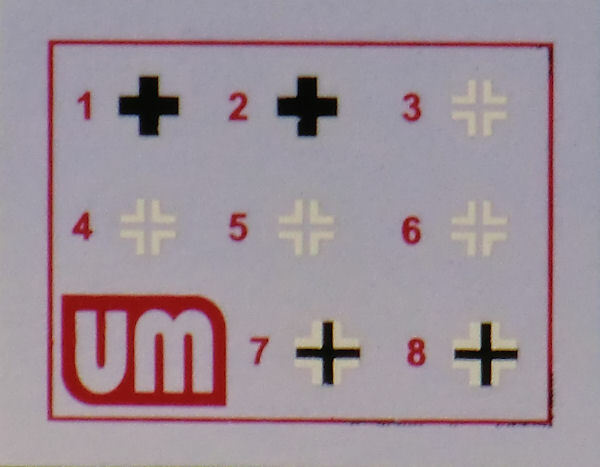 I've contacted UM via email, have waited two weeks for a response, but have not received any sort of a reply. 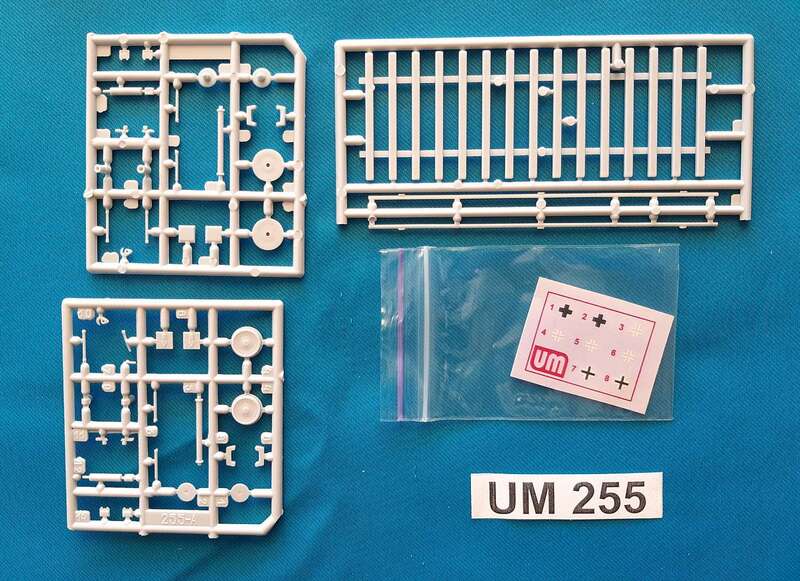 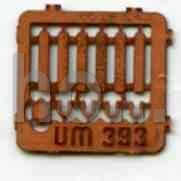 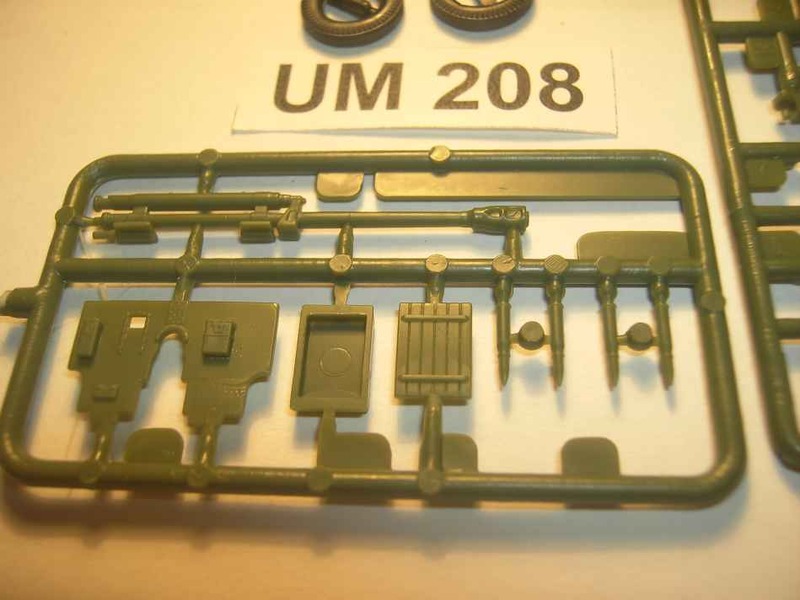 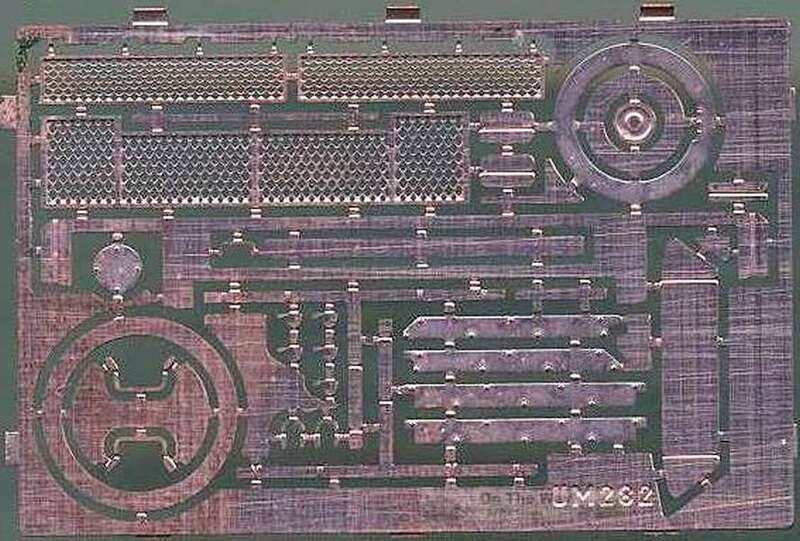 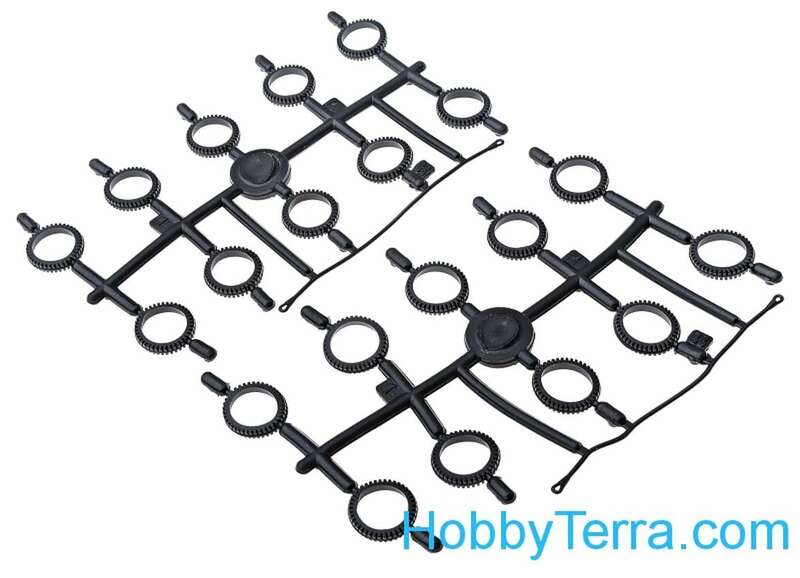 I had hoped that UM would have at least had some interest in rectifying this and provide me with a new sprue. 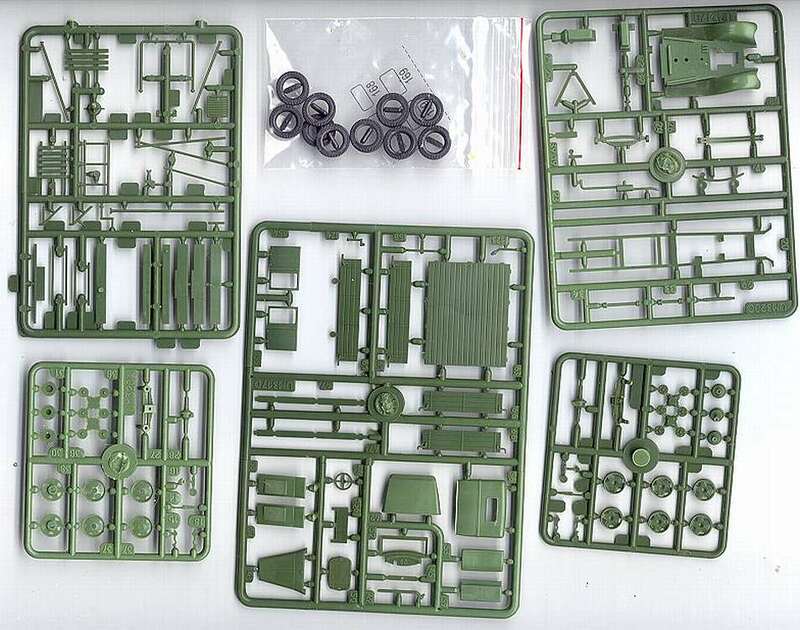 It would be in their best interests to keep a member of the modeling public happy and avoid getting a bad rap for poor quality kits. 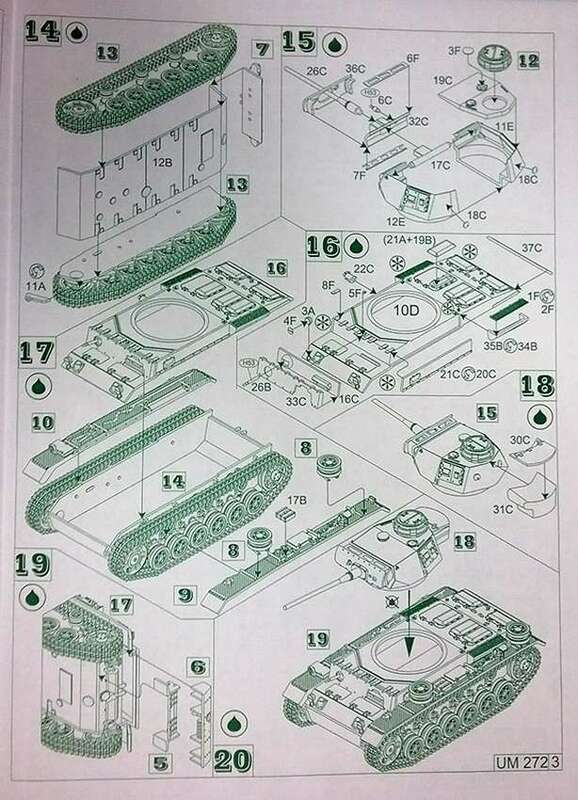 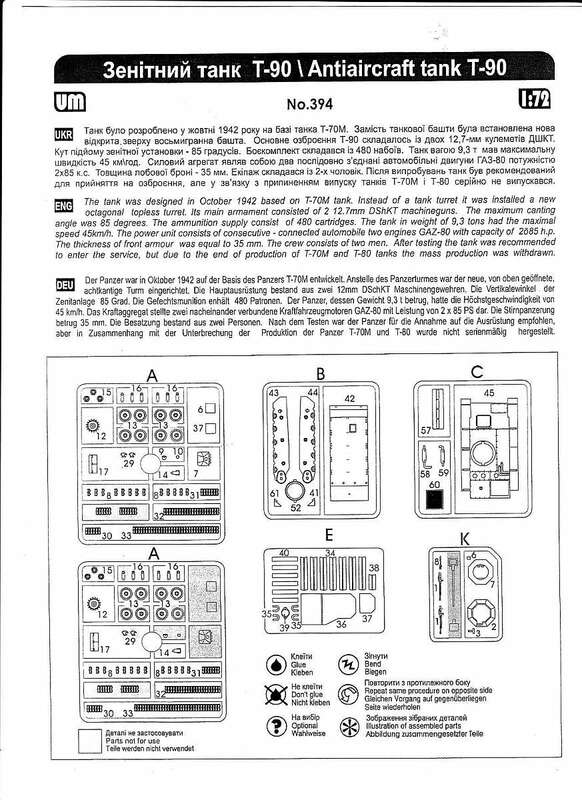 But alas, this does not appear to be the case, so as a result I now warn others thinking of buying this kit that they will possibly be in for a nasty surprise upon opening the box. 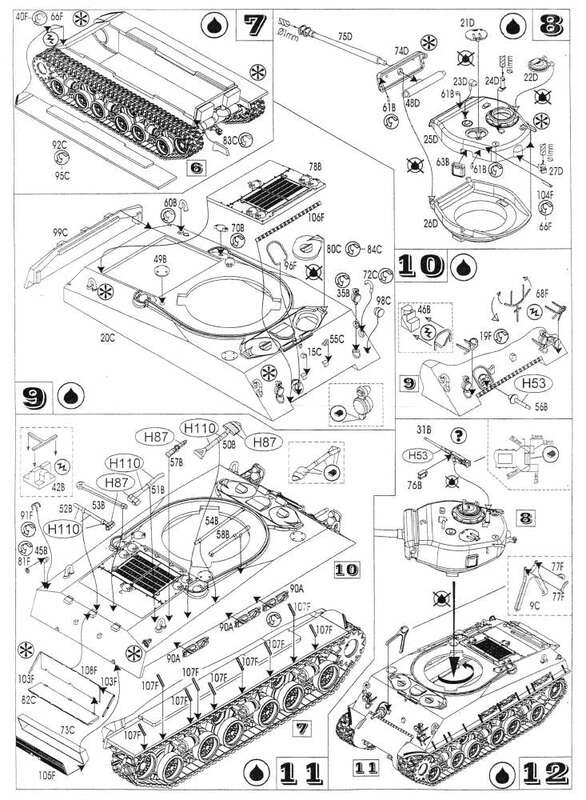 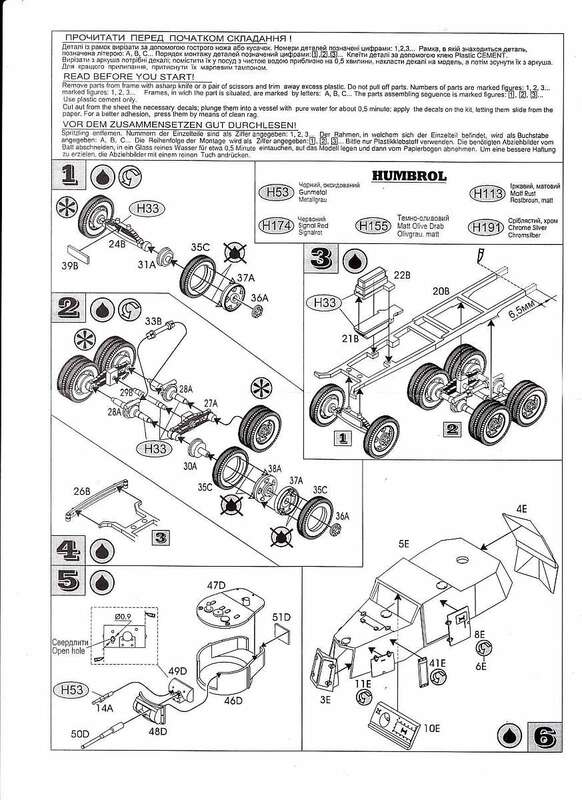 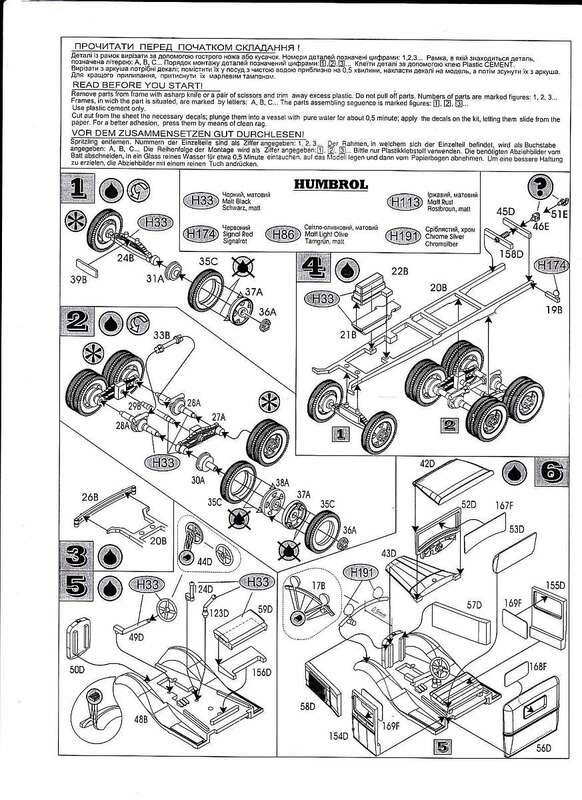 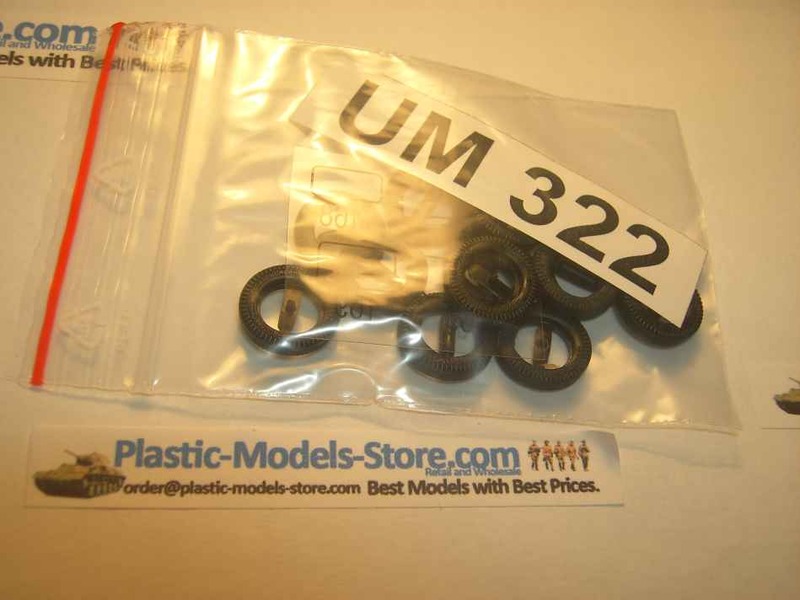 After the mail from Al Magnus, has UM promised to send new parts. 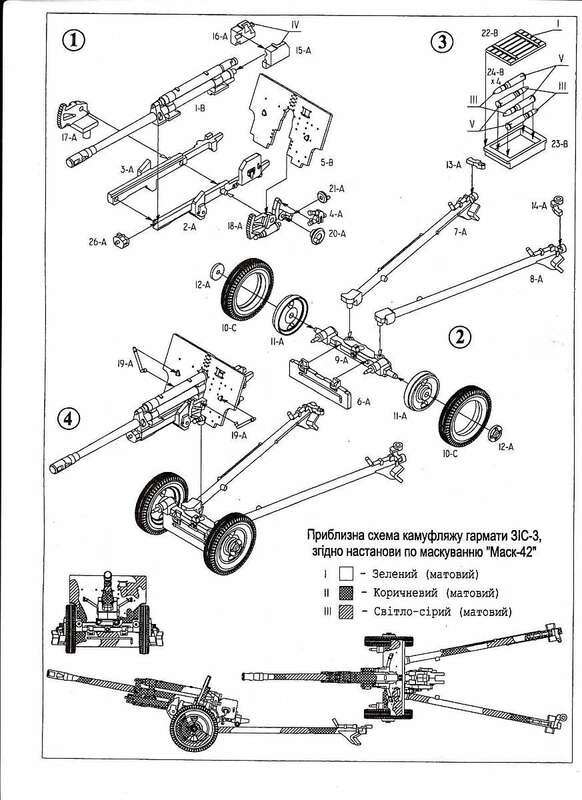 But the parts were never received. 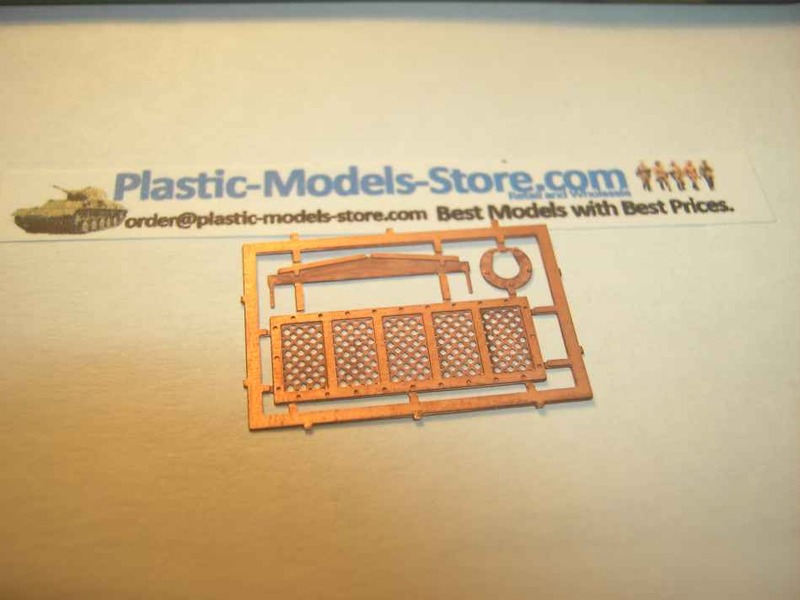 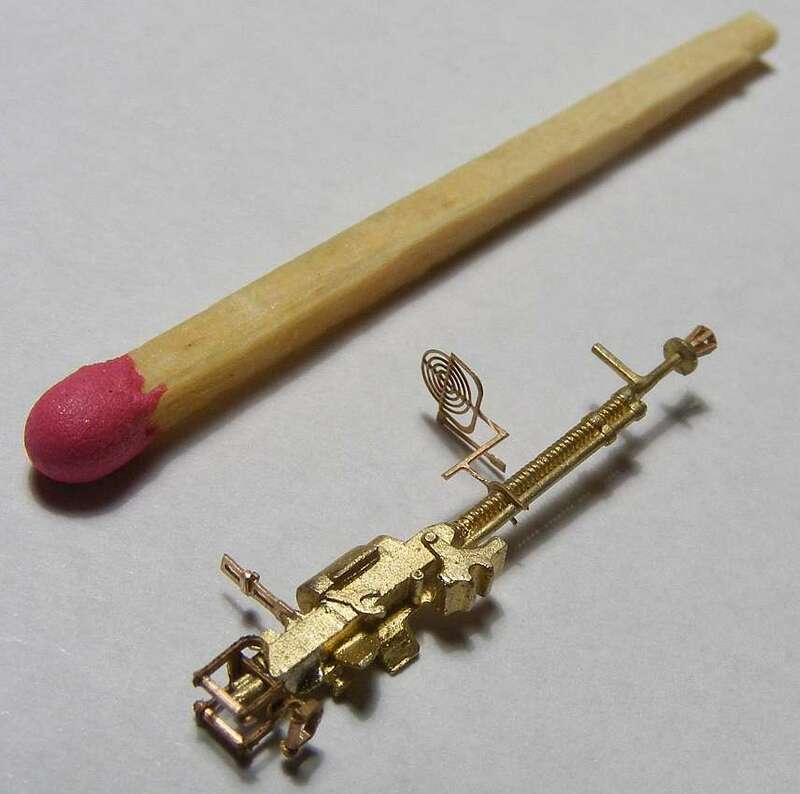 The online shop "Always Models" was so kind to send new parts. 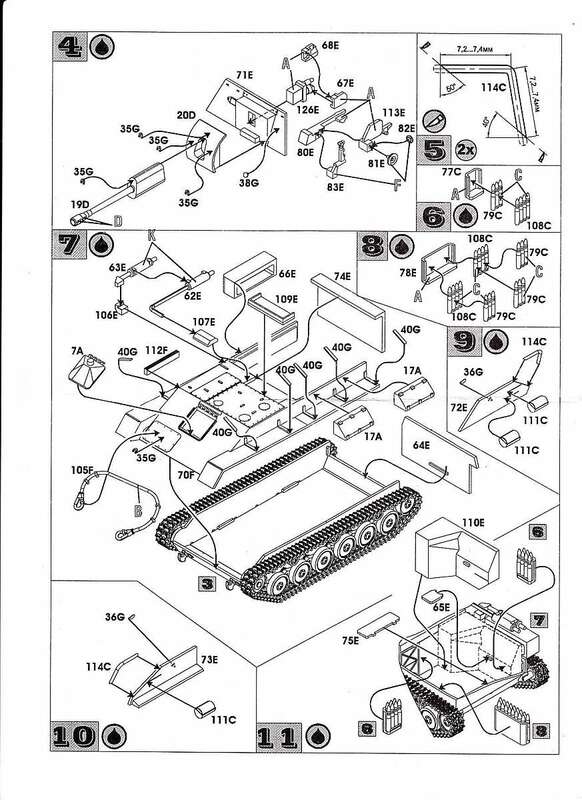 What is the problem? 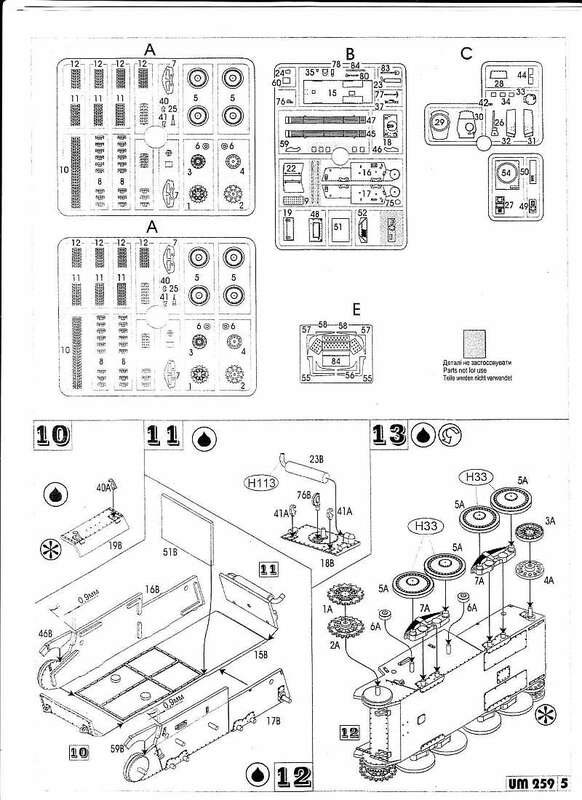 - Who can help me with a solution? 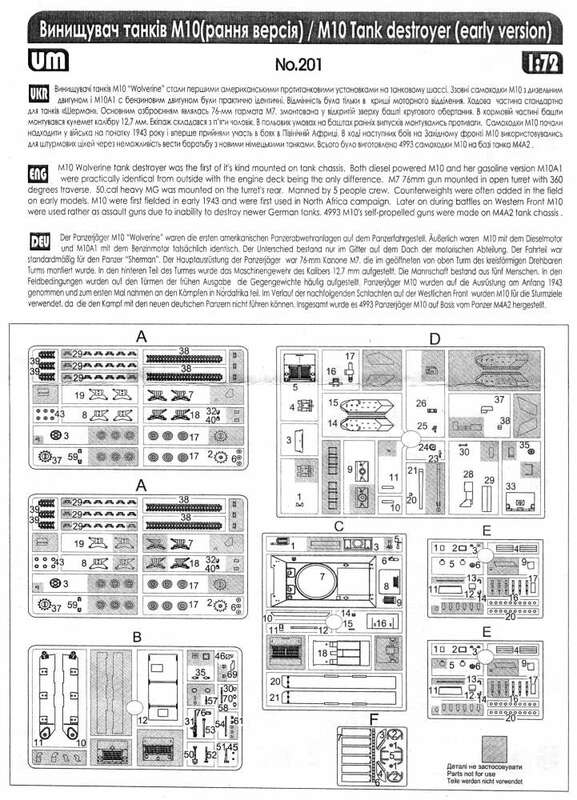 The link to the UM website is deleted. 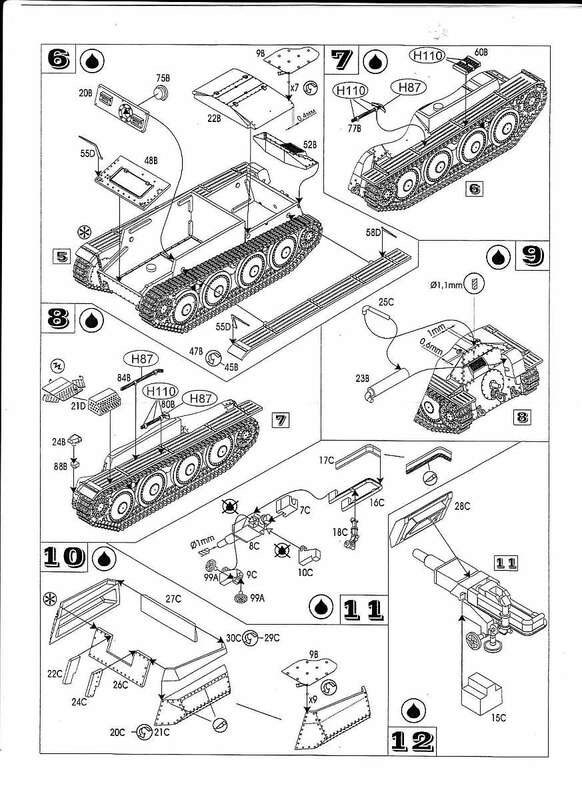 The website is "Out of working"